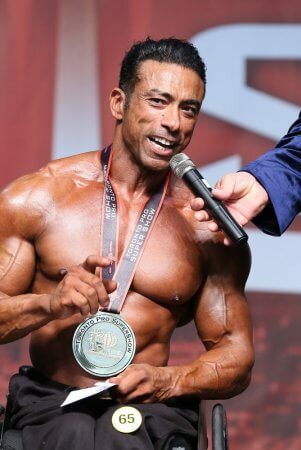 Antoni Khadraouri was born on February 23, 1970 in the South of France. 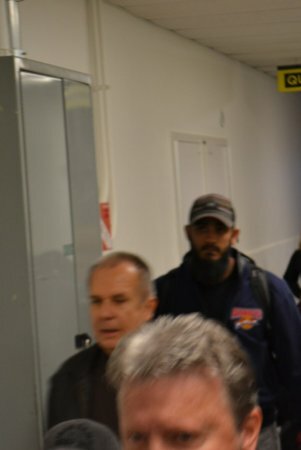 He currently resides in Uppsala, Sweden and he calls it his home. 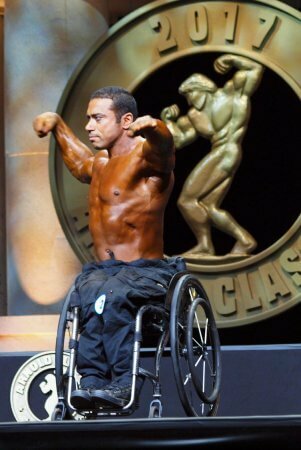 At the very young age of 17, Antoni joined the Army. 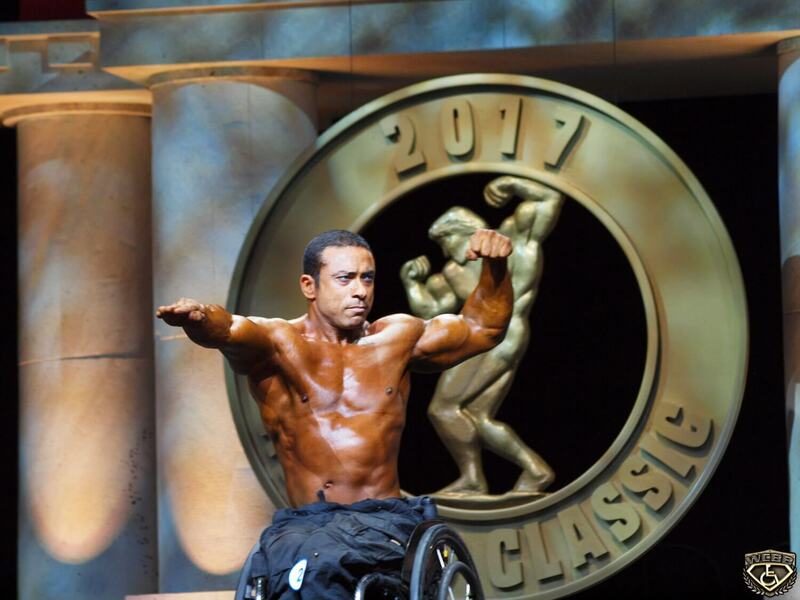 While enlisted in the Army in the year of 1990 Antoni was involved in a war accident that included over 200 people where he was critically injured. 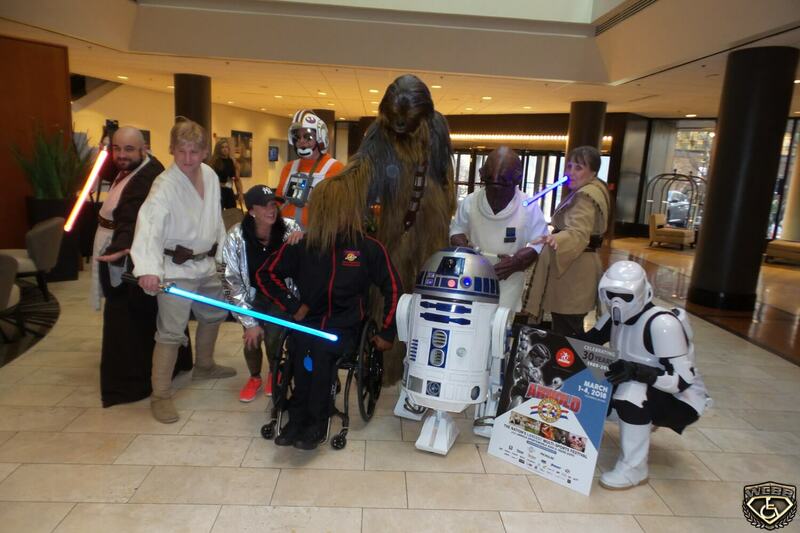 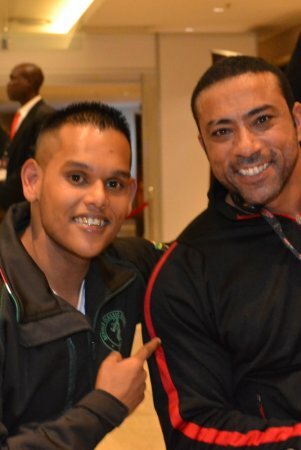 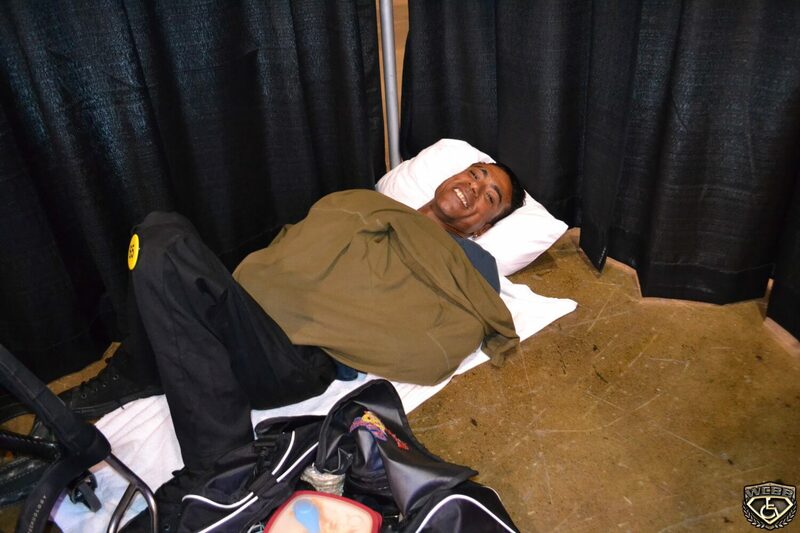 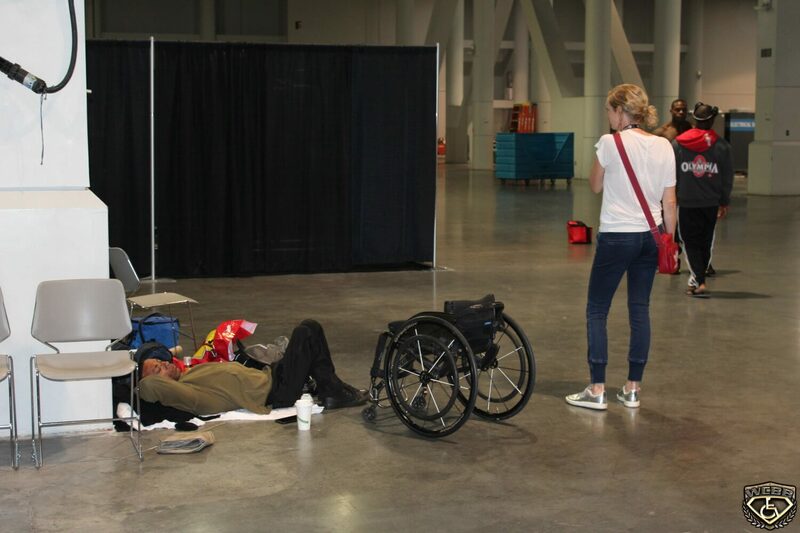 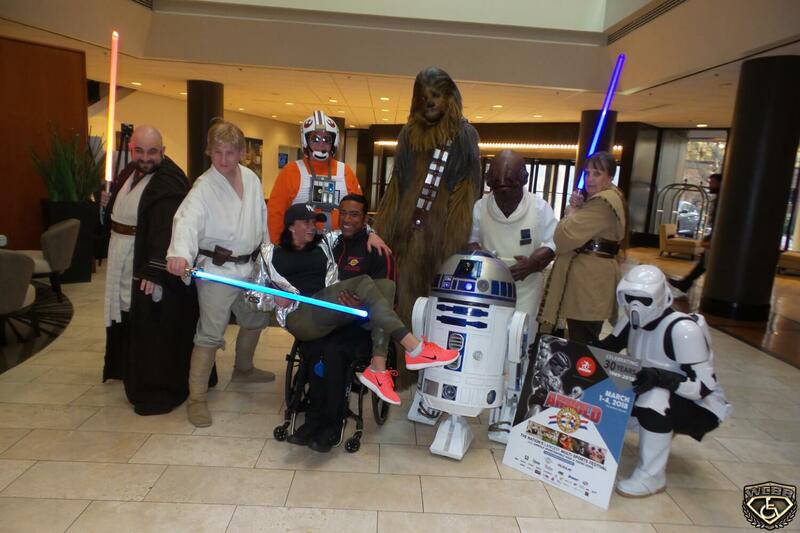 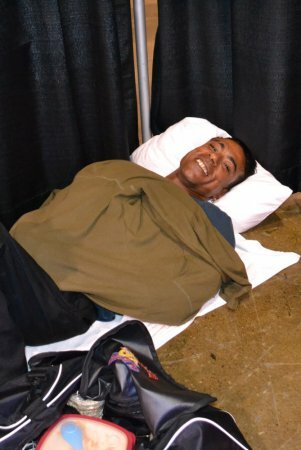 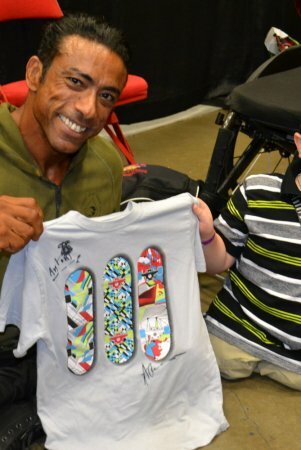 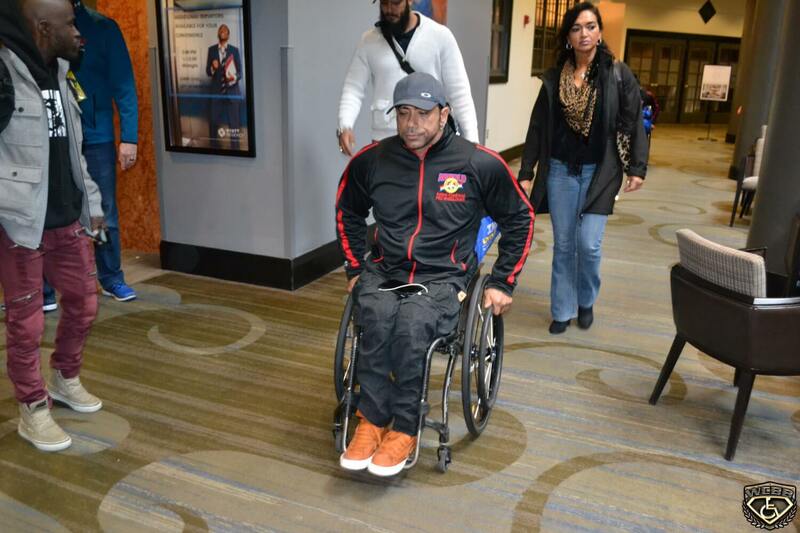 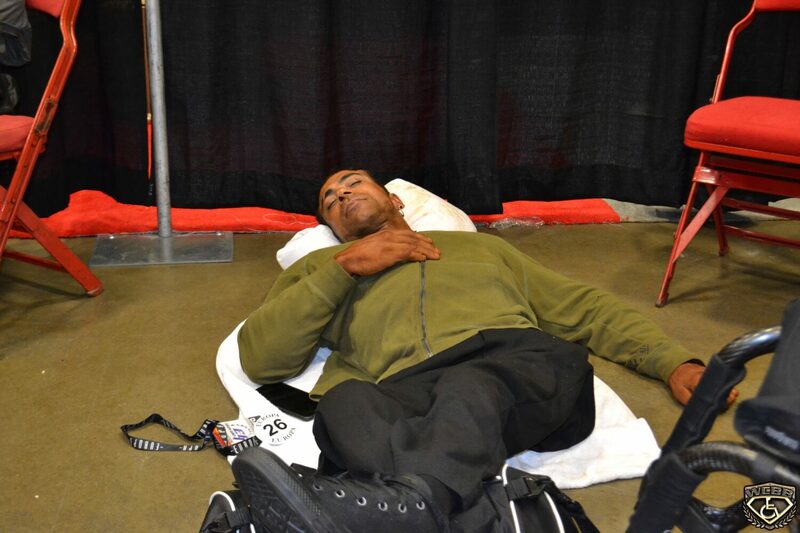 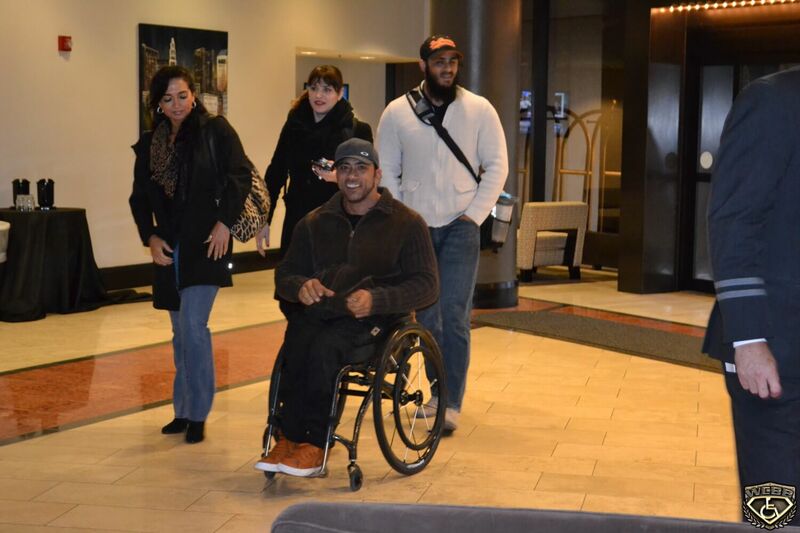 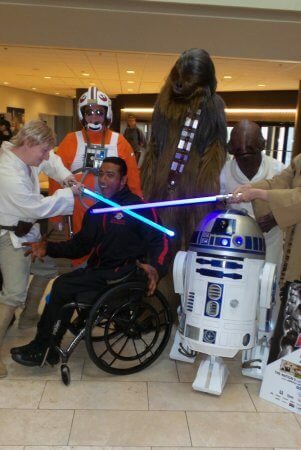 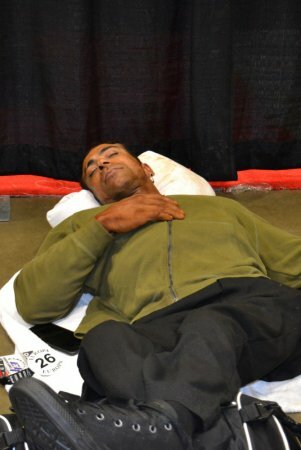 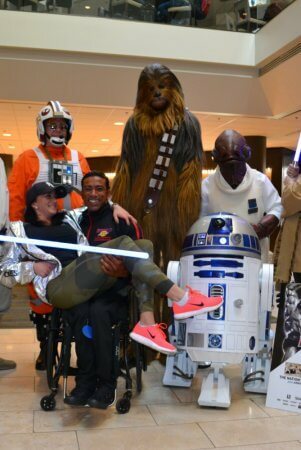 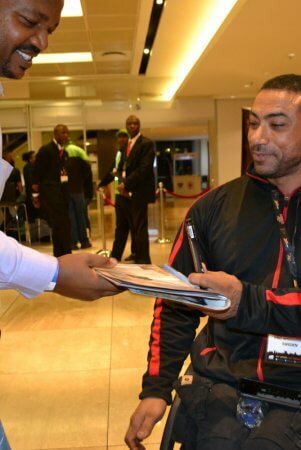 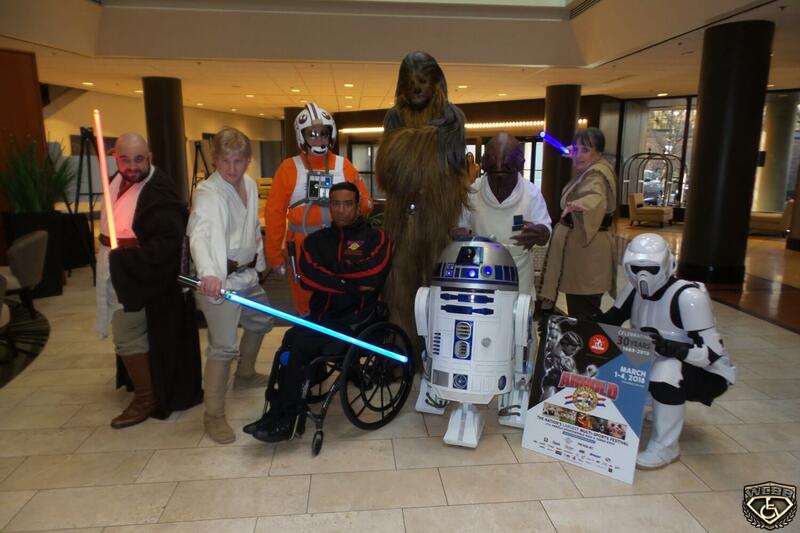 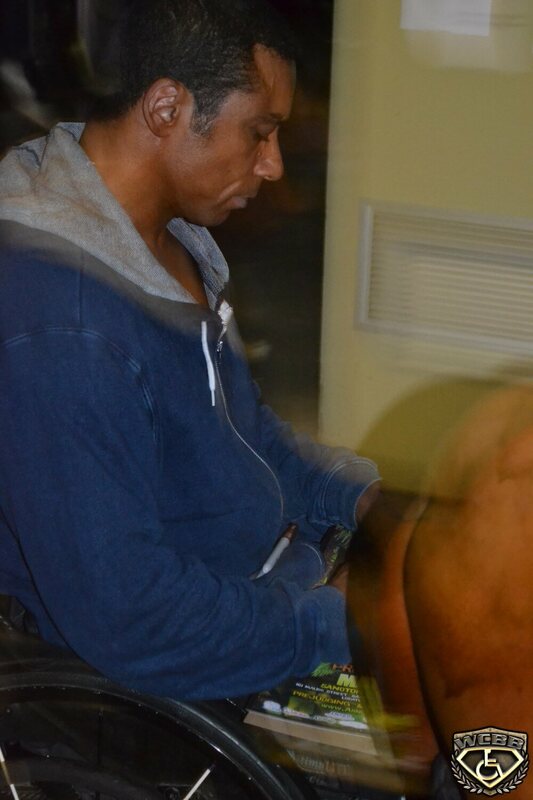 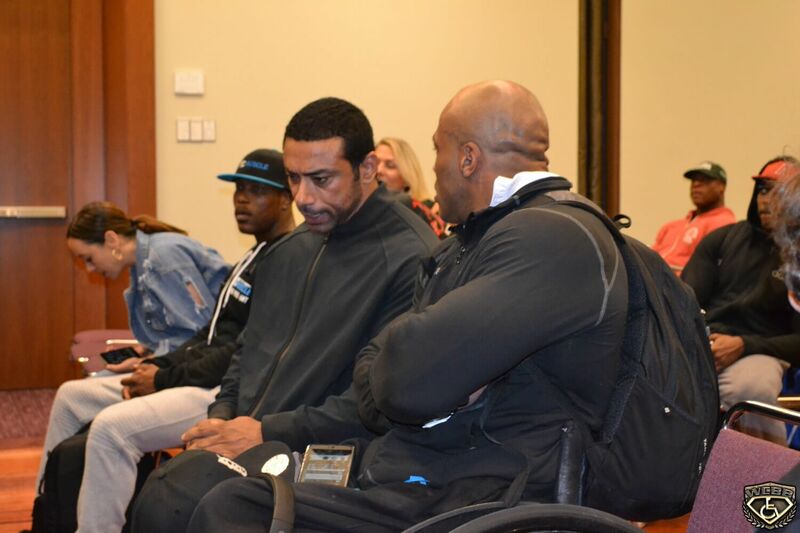 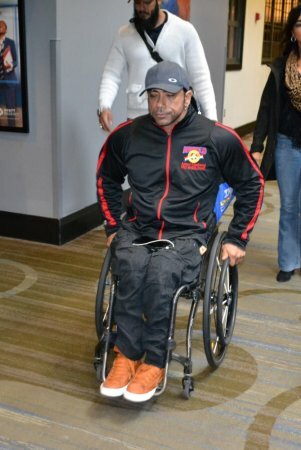 After waking up in the hospital he was told that he had suffered injuries to the T12 of his spinal cord. 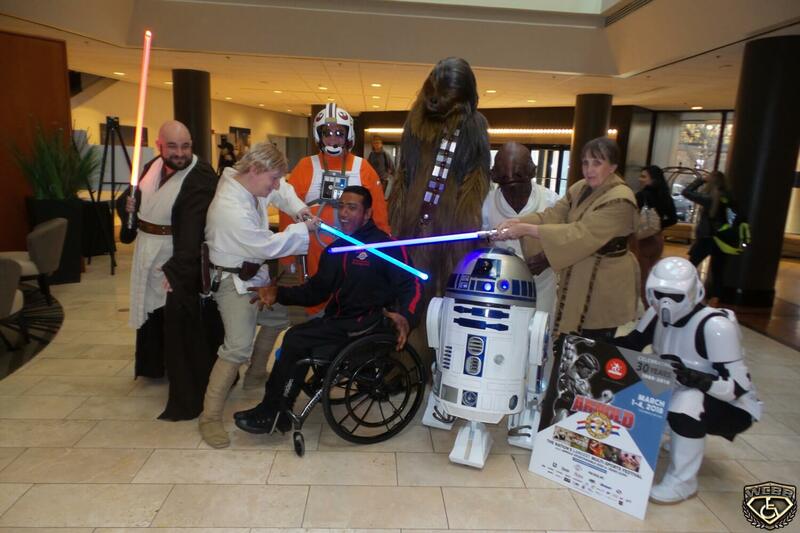 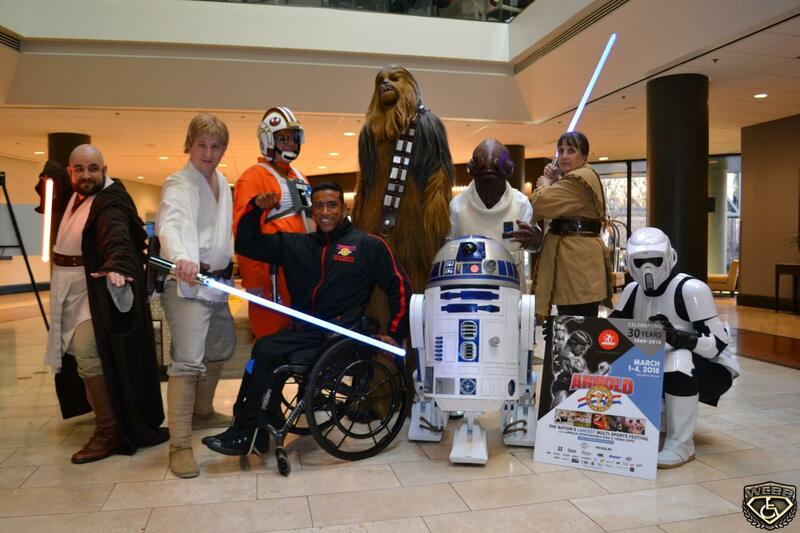 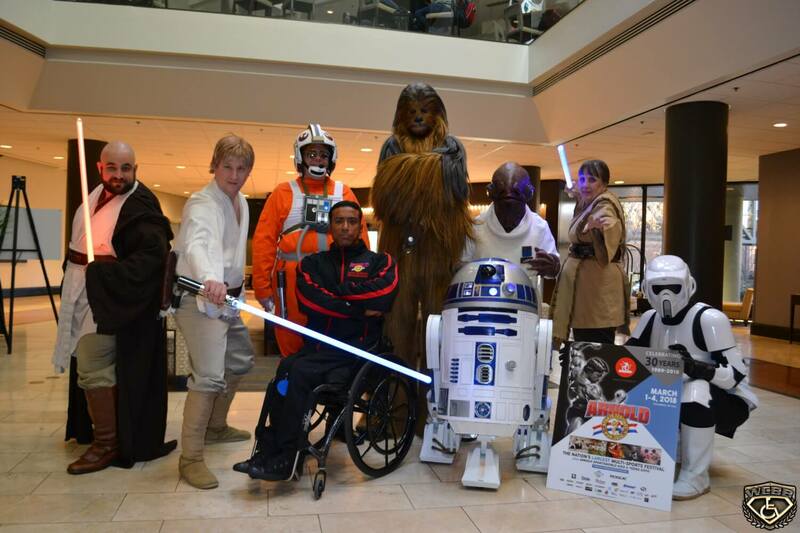 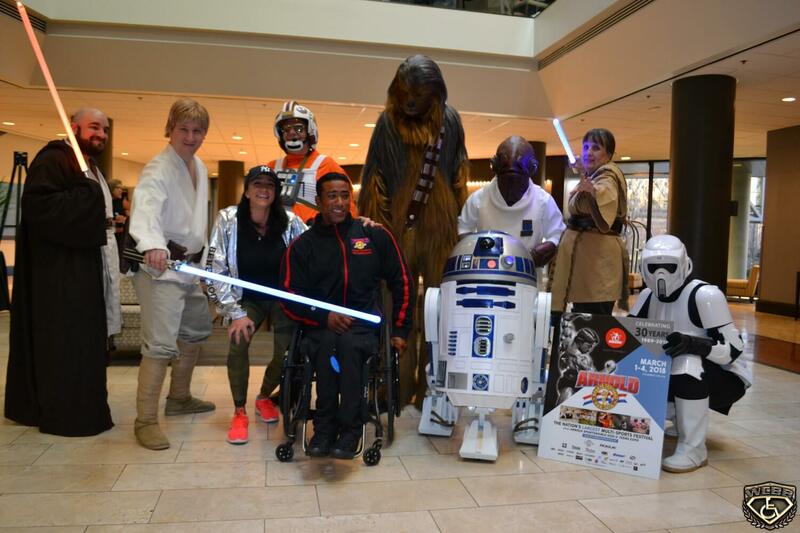 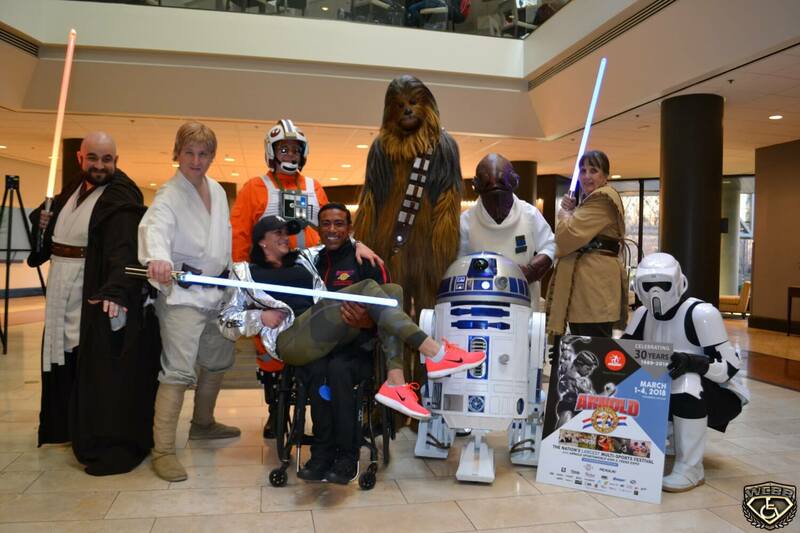 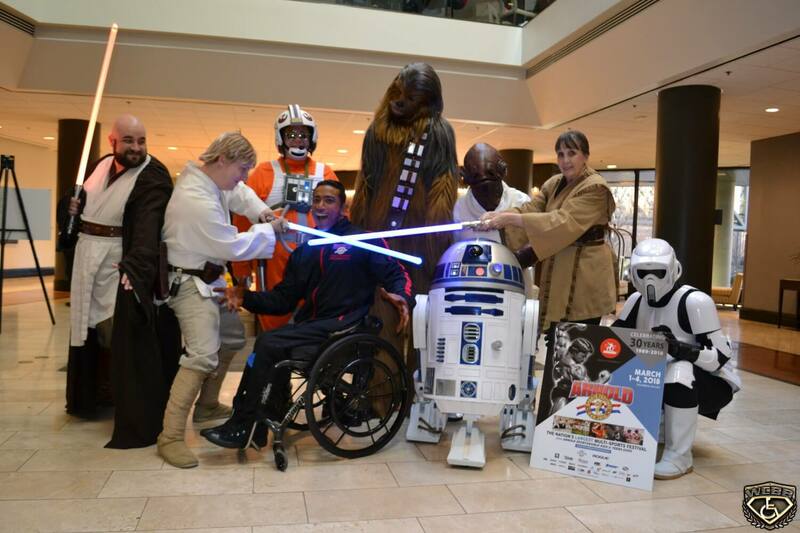 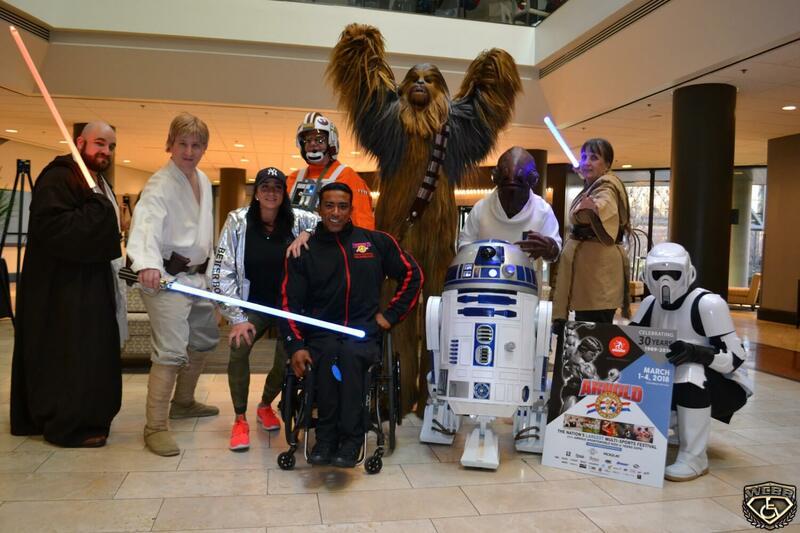 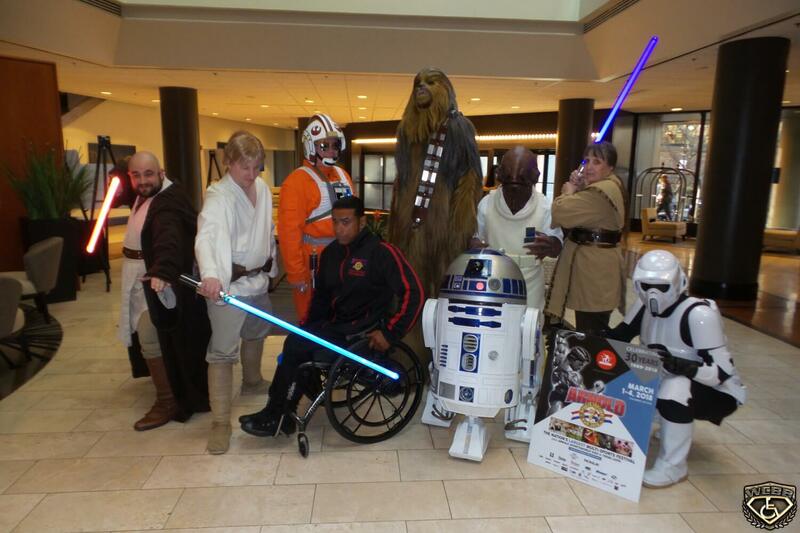 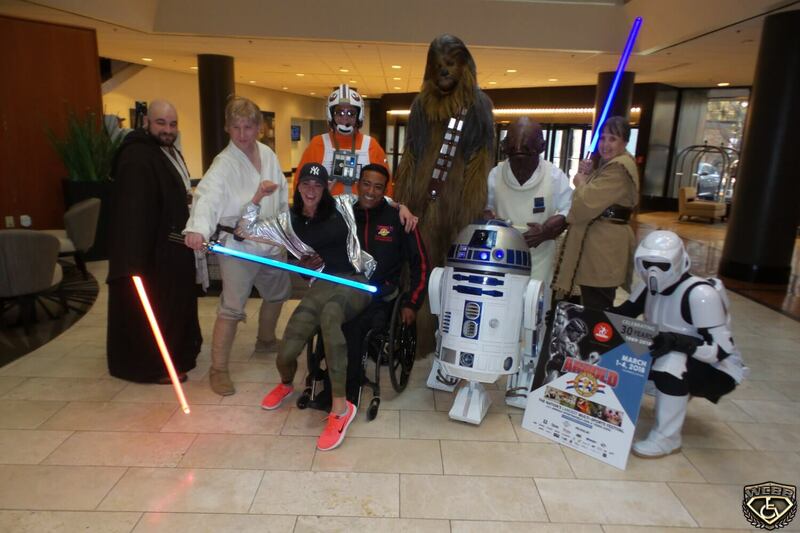 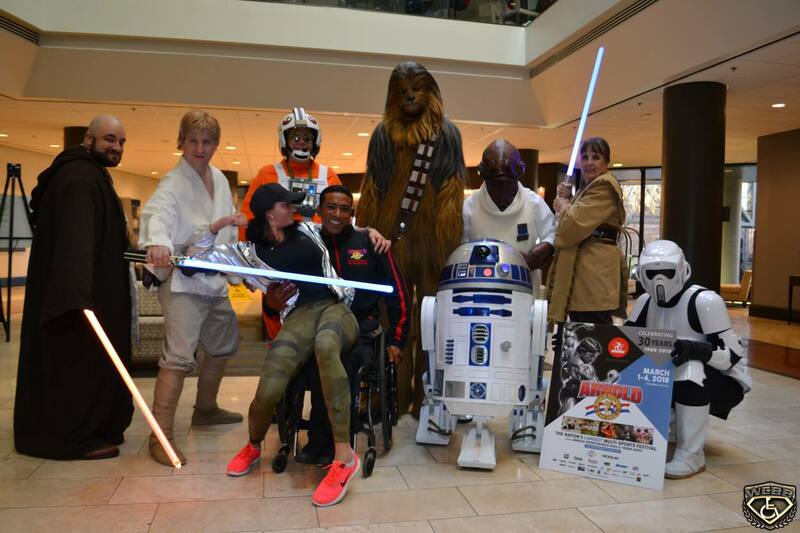 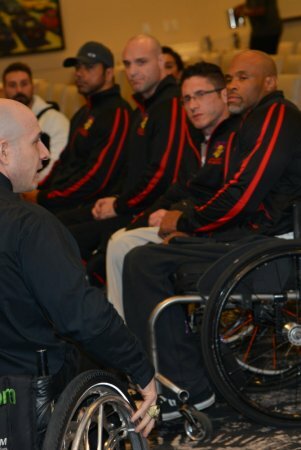 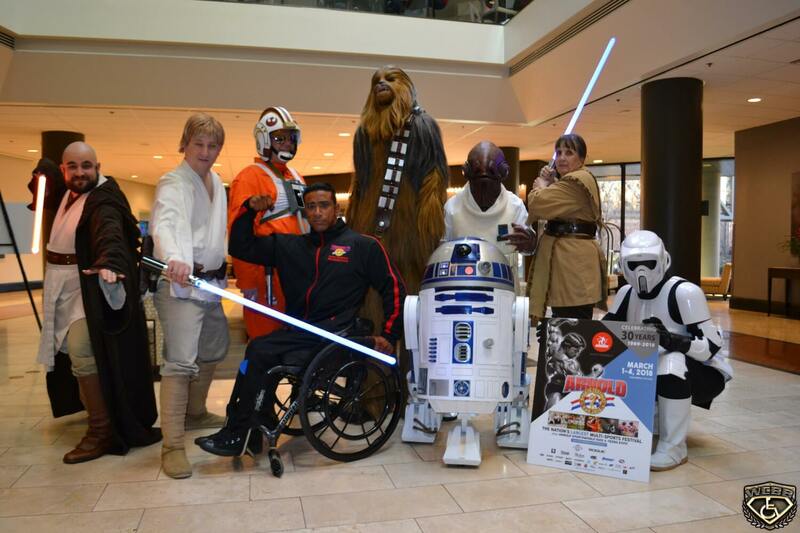 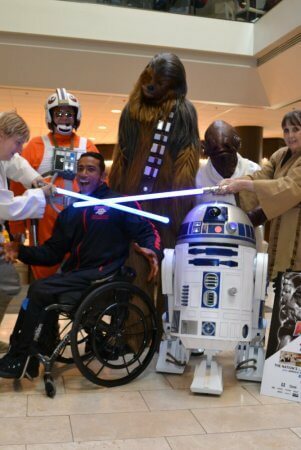 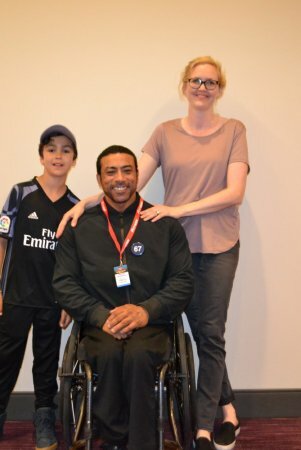 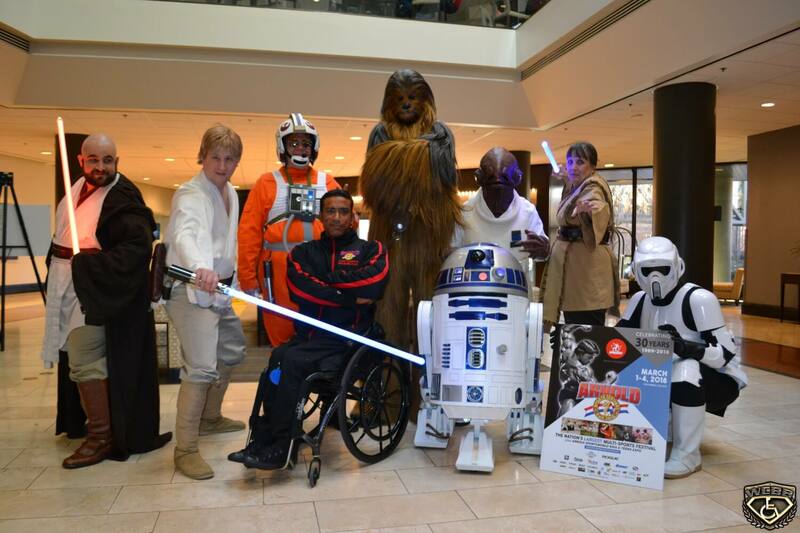 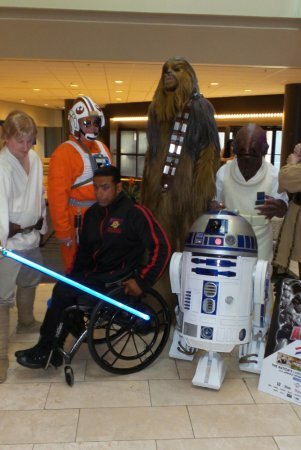 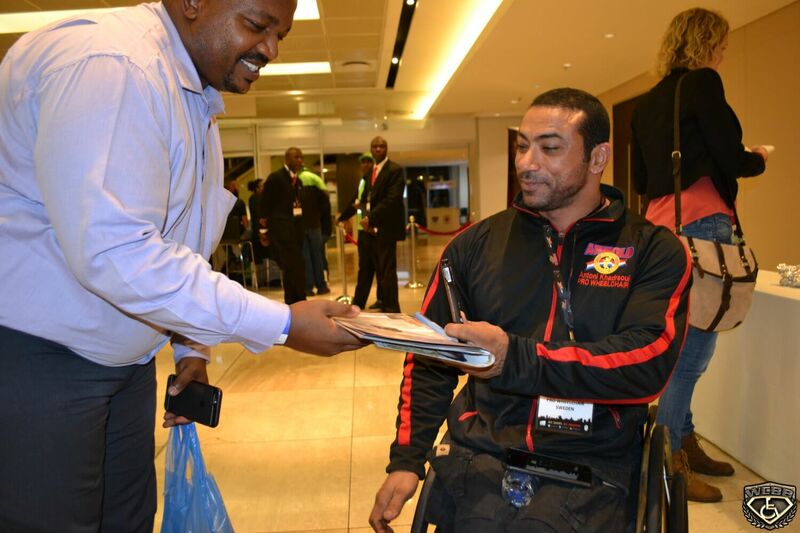 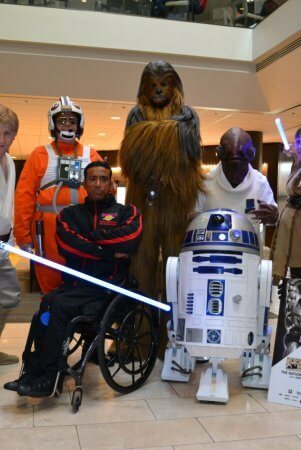 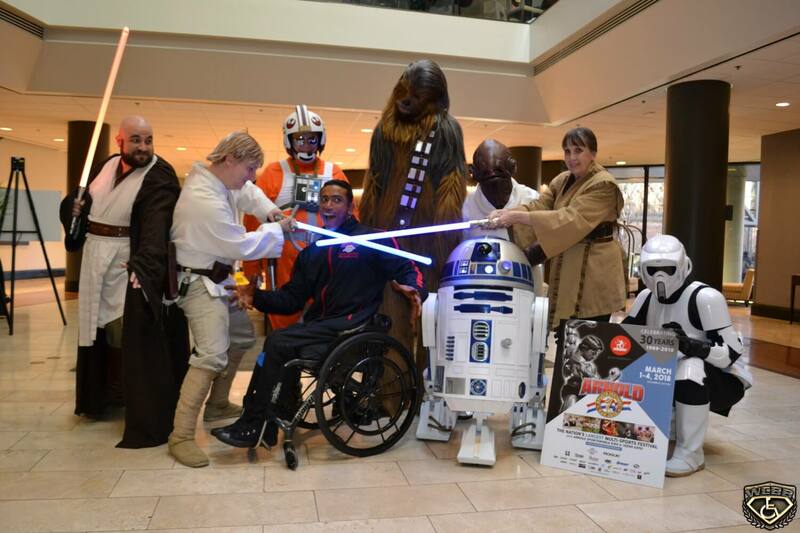 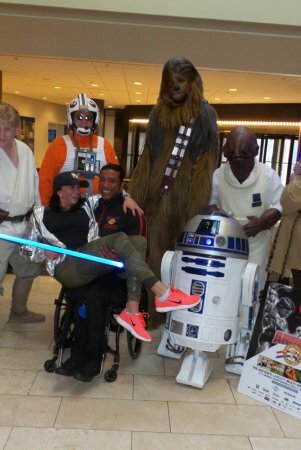 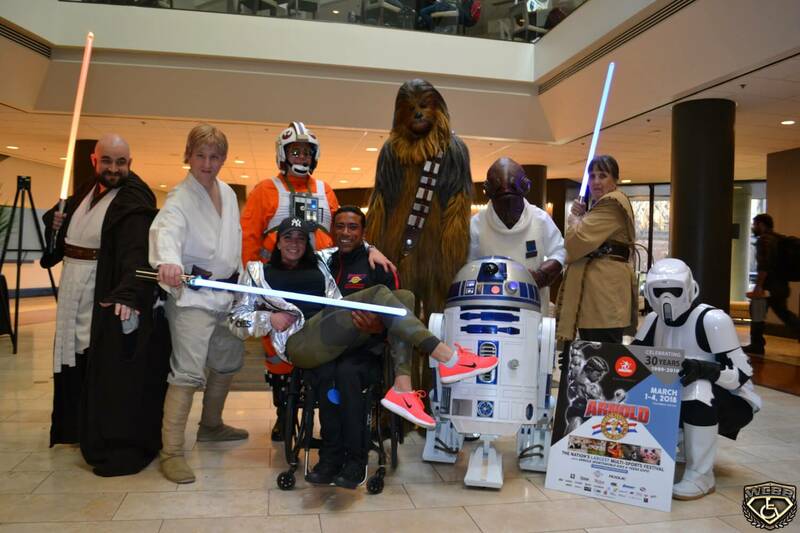 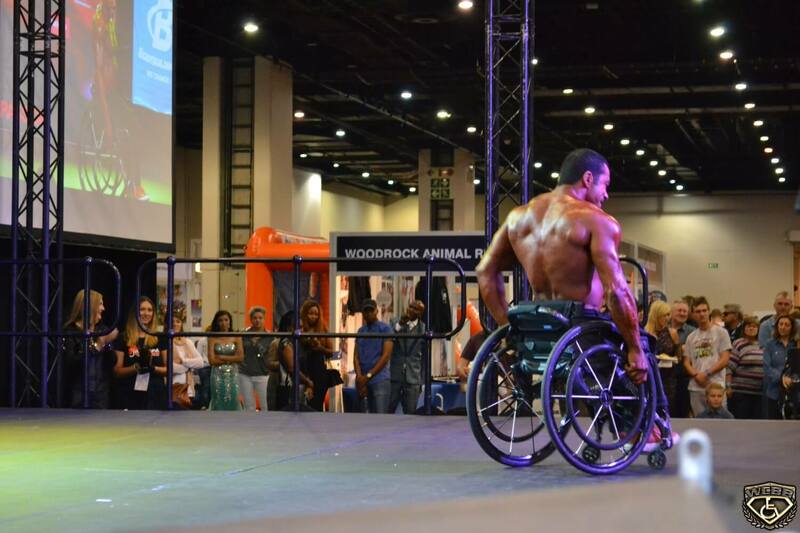 Antoni could not feel his legs and was permanently paralyzed. 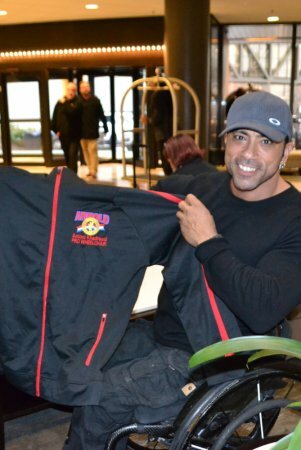 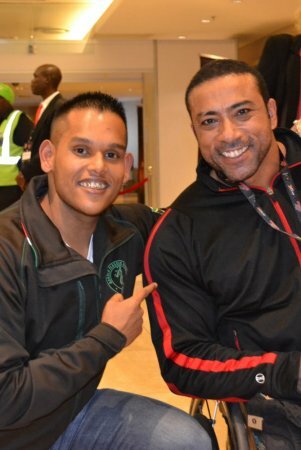 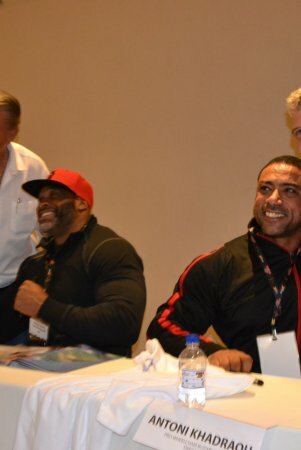 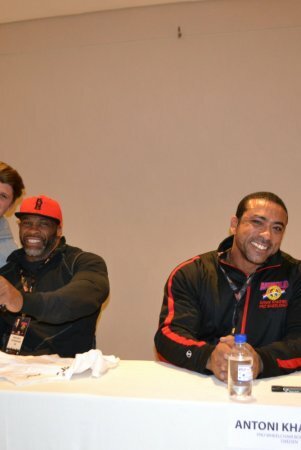 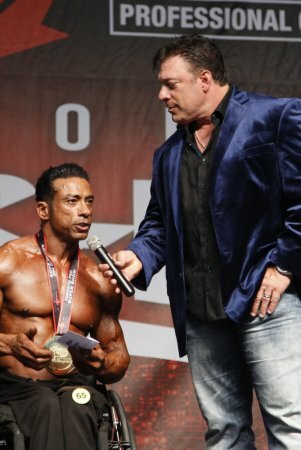 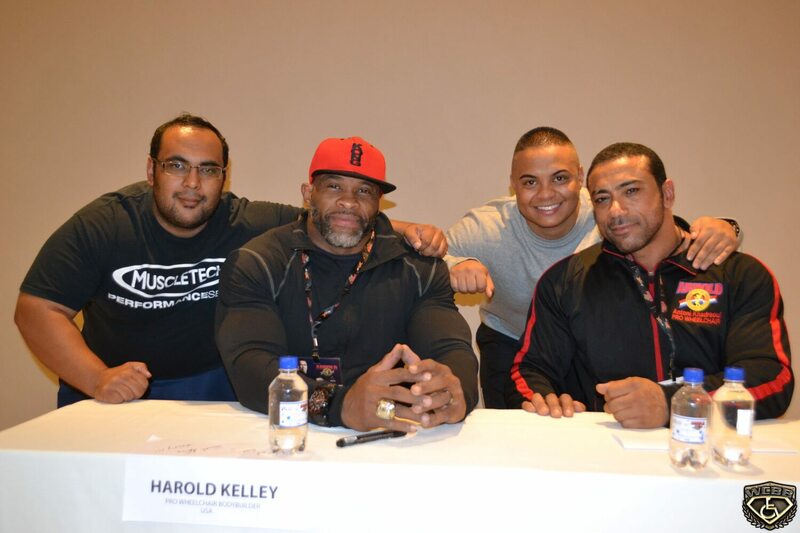 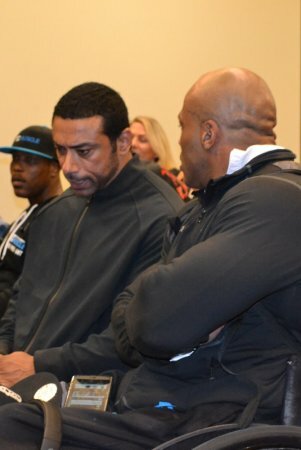 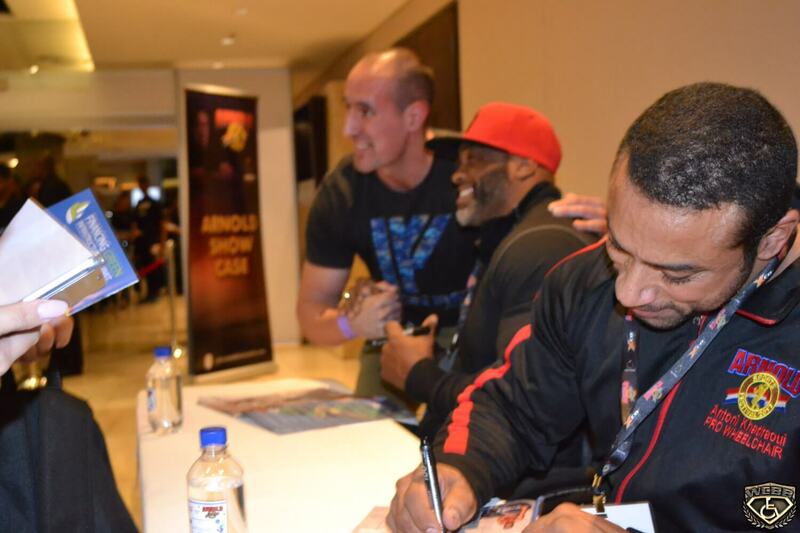 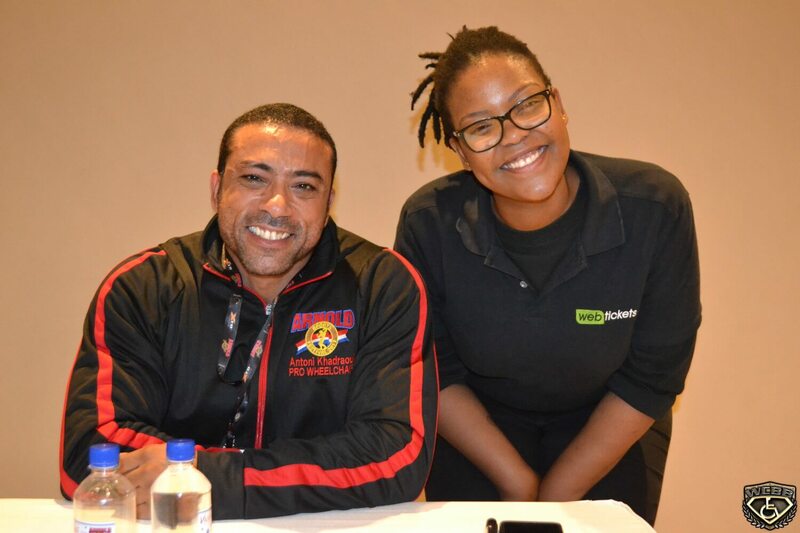 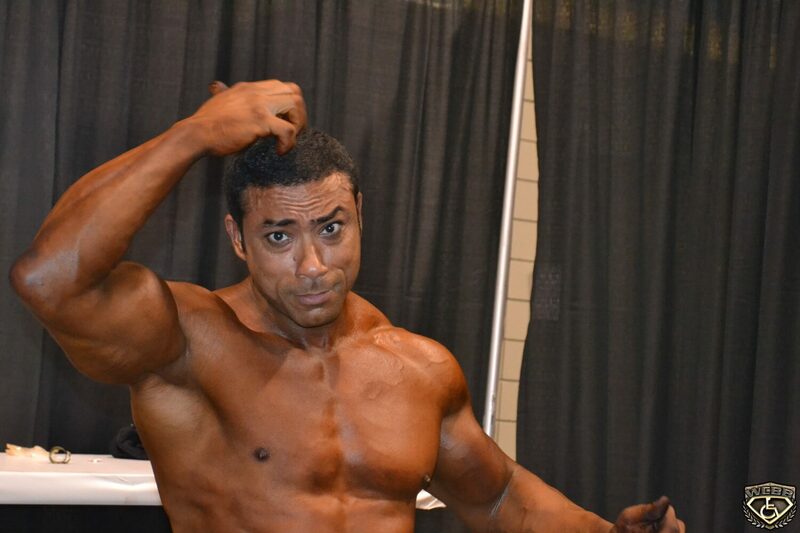 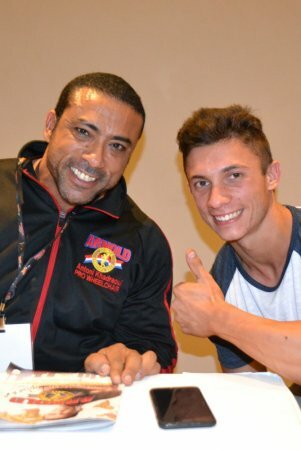 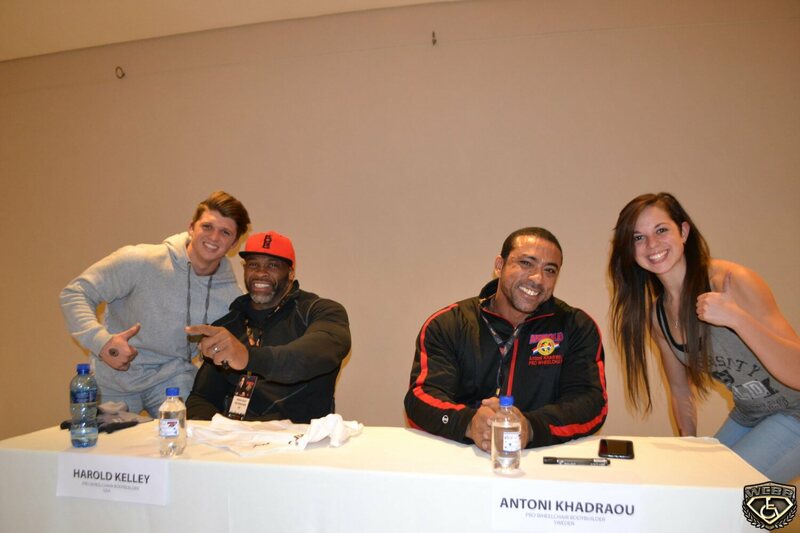 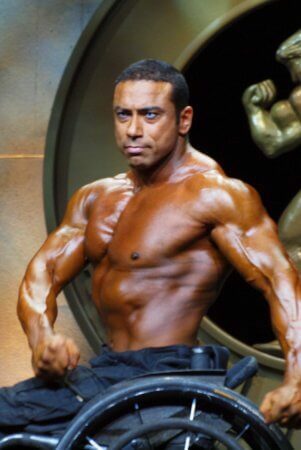 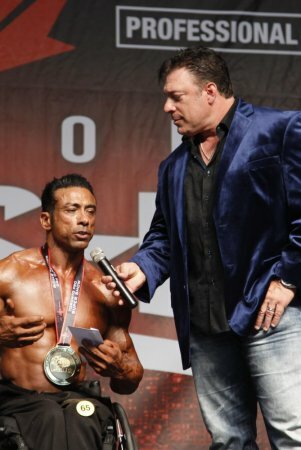 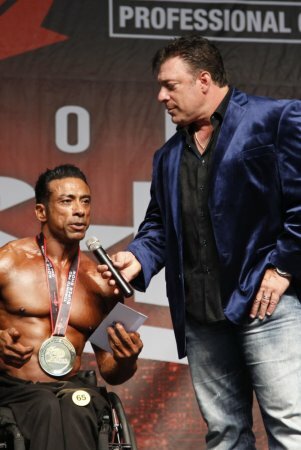 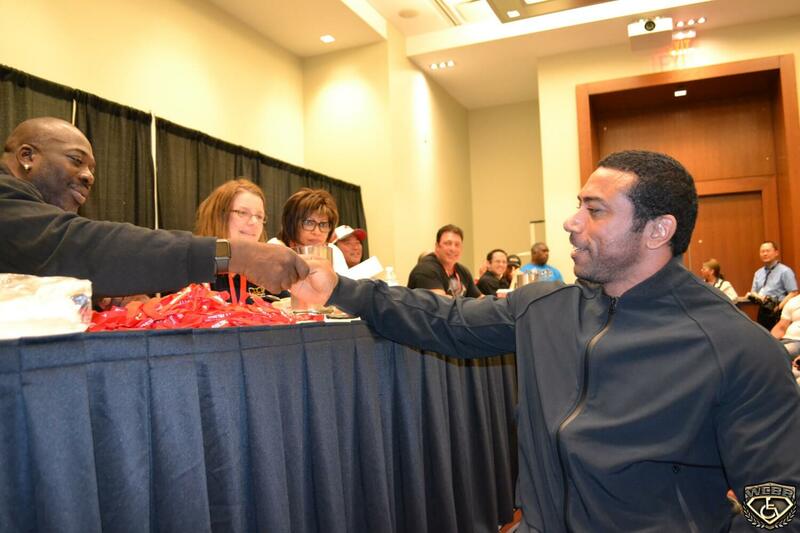 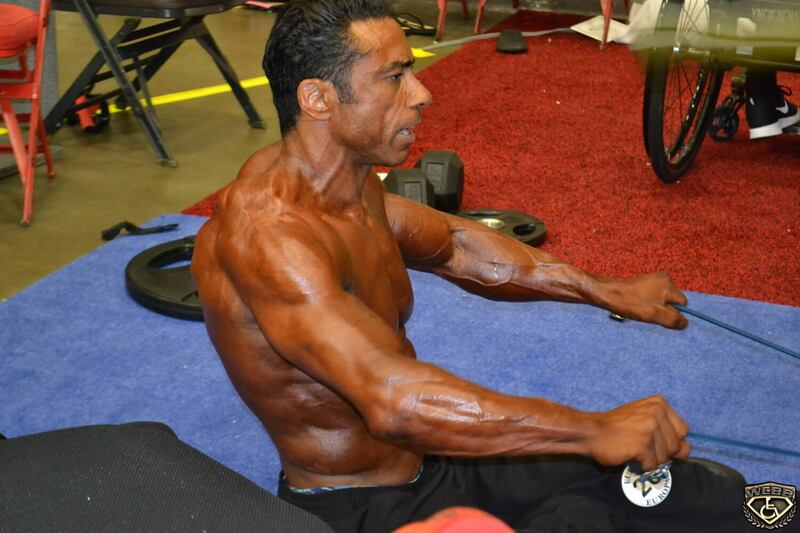 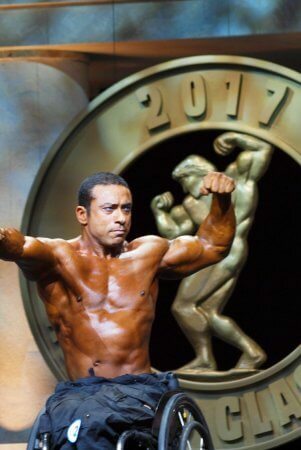 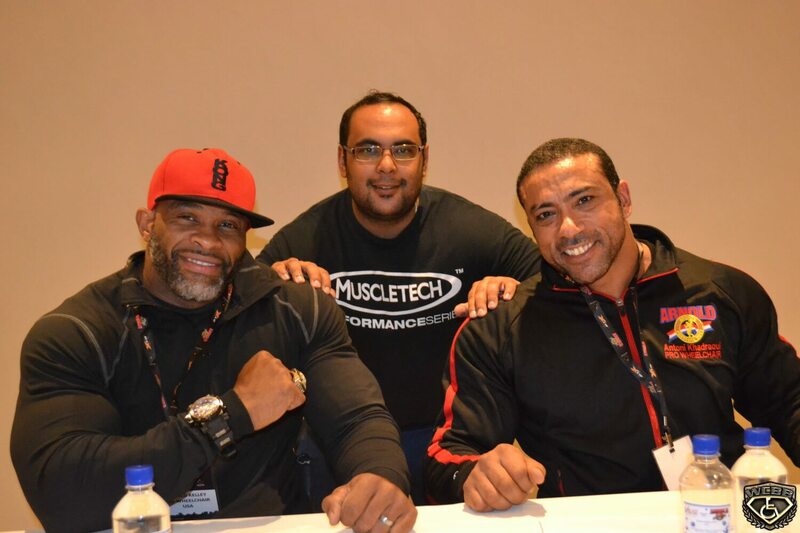 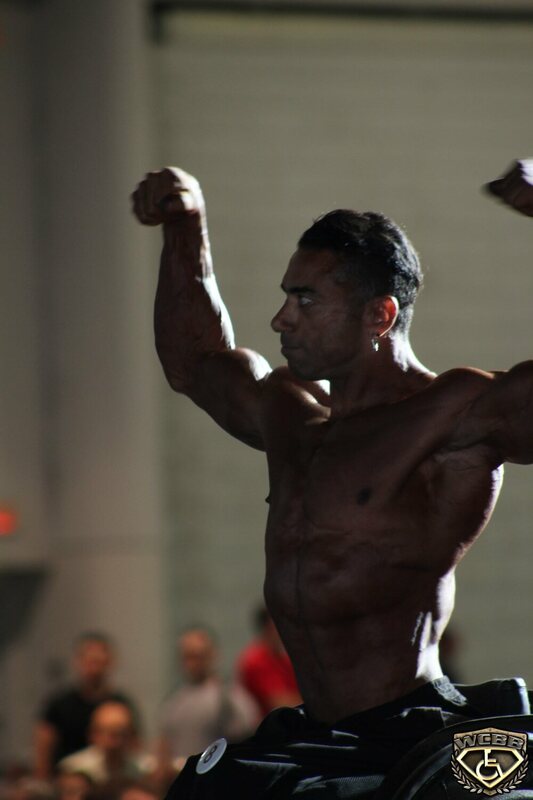 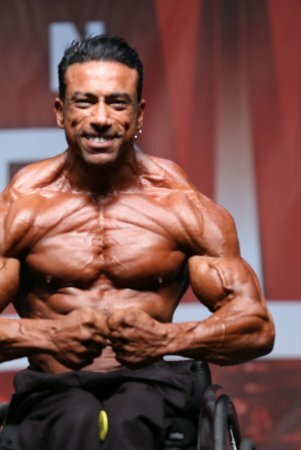 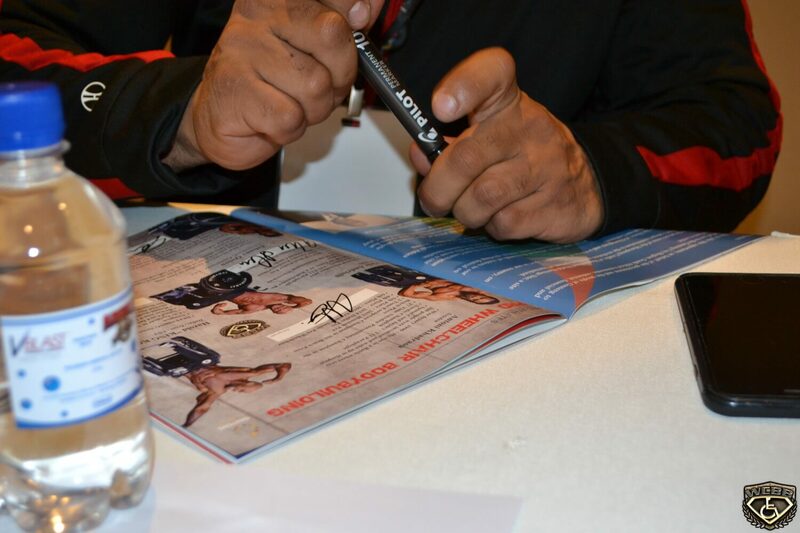 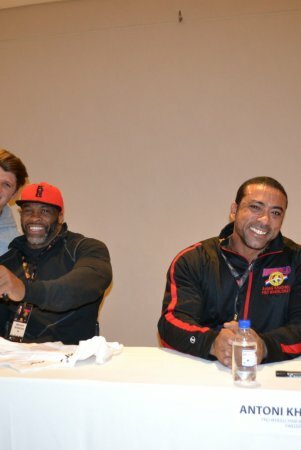 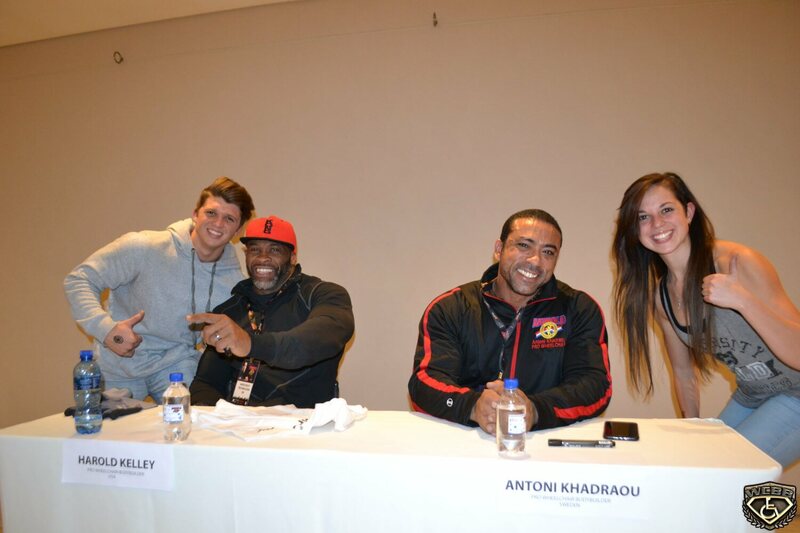 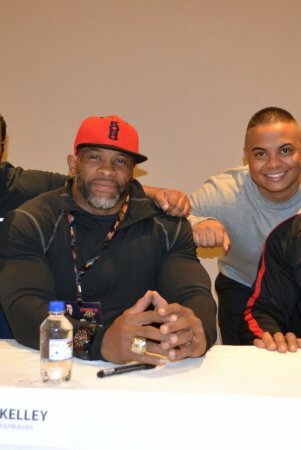 As a teen, he had always dreamed of participating in the Olympia and even becoming Mr. Olympia. 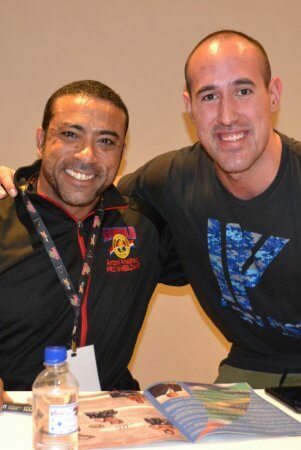 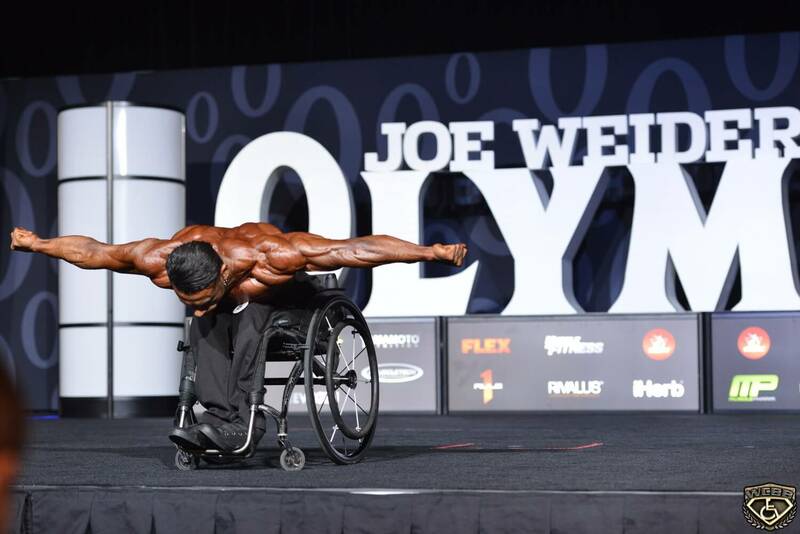 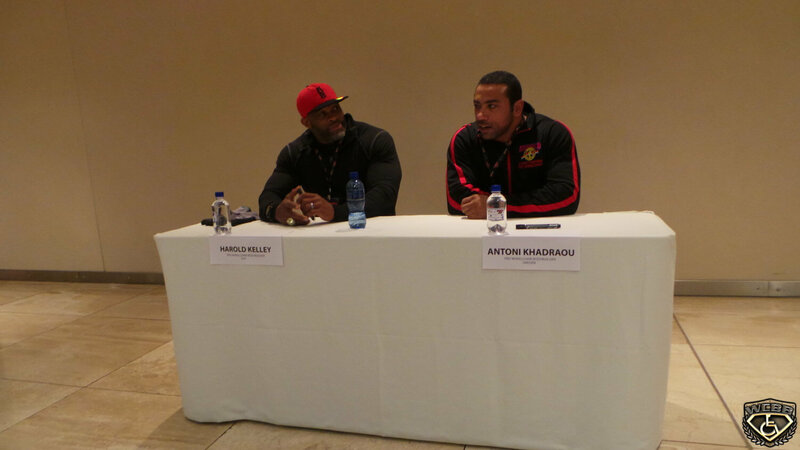 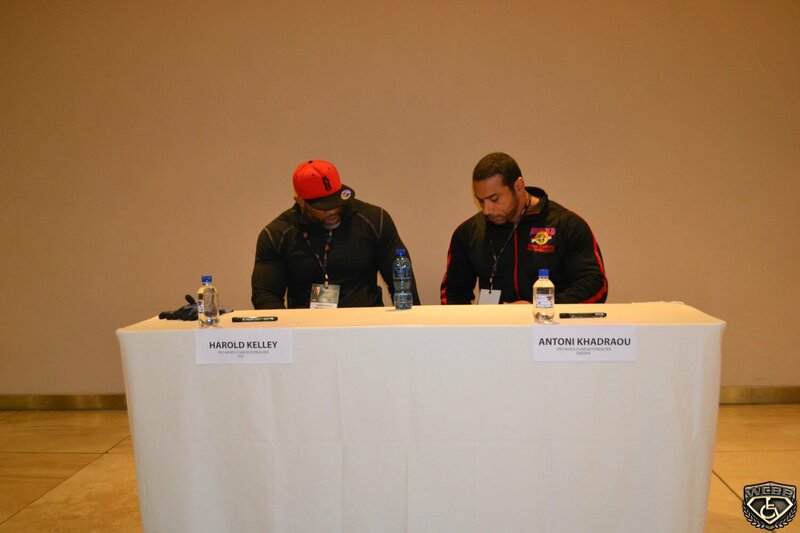 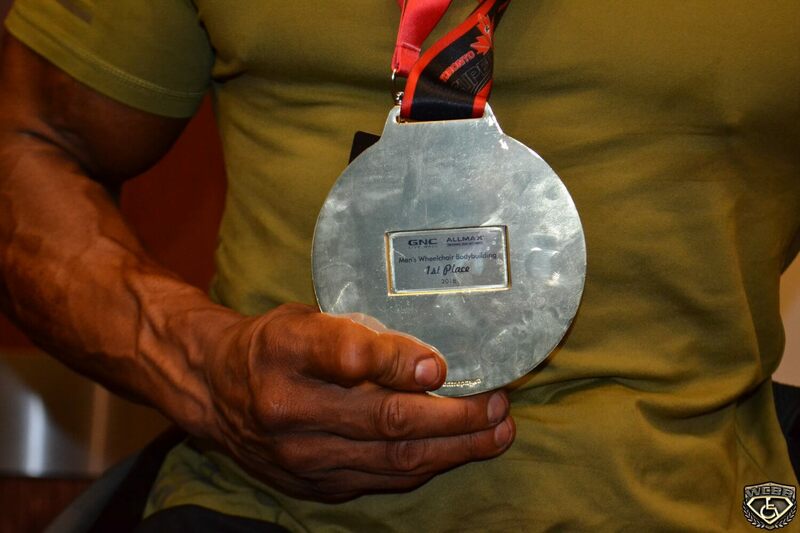 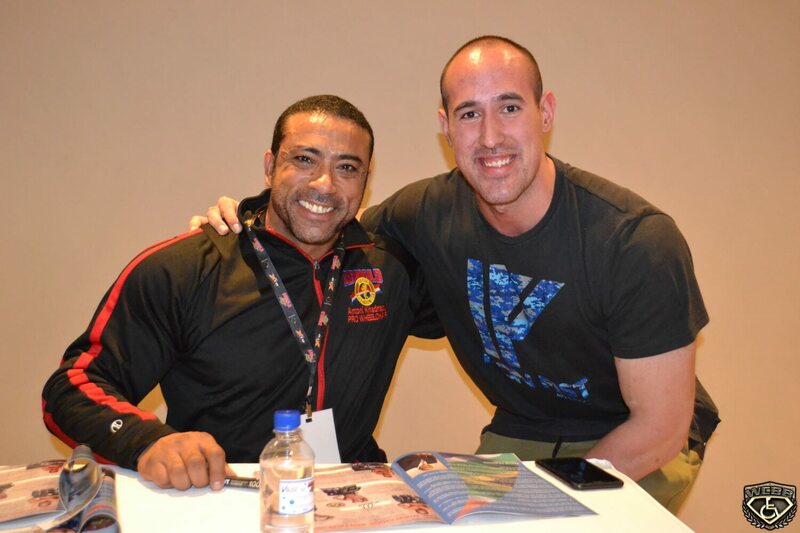 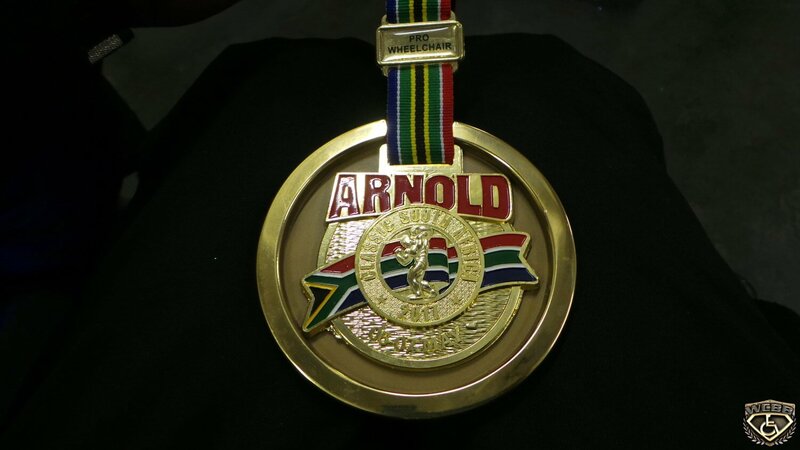 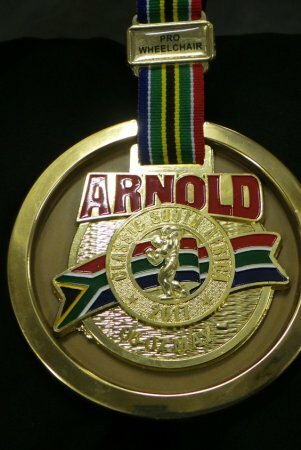 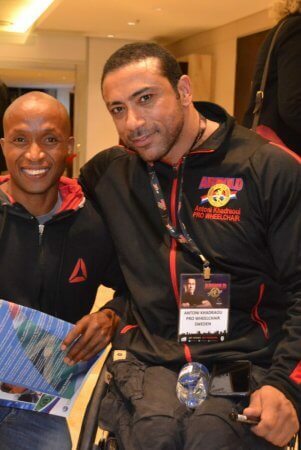 Although his home country did not offer the Olympia’s he persevered with his training regardless. 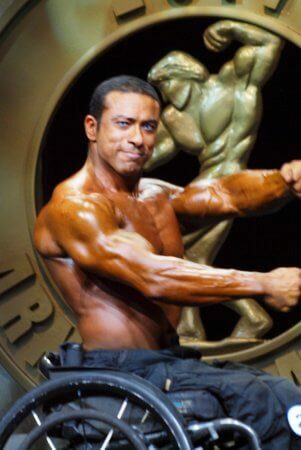 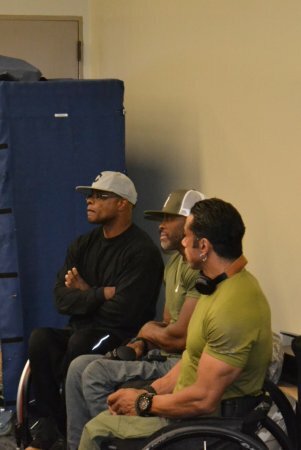 He began training in 1992 and worked mainly on his biceps which were his favorite muscles to work on. 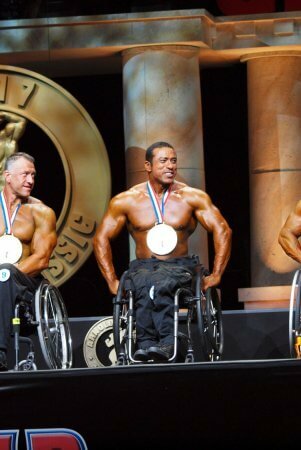 for bench pressing and that would offer him the best results in the Power Lifting Competitions. 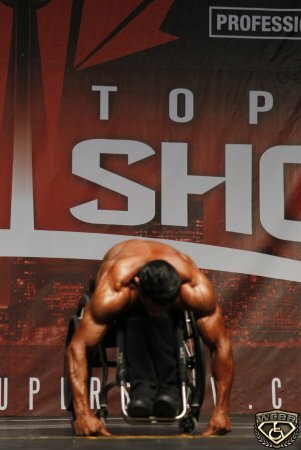 He won many competitions which only encouraged him even more. 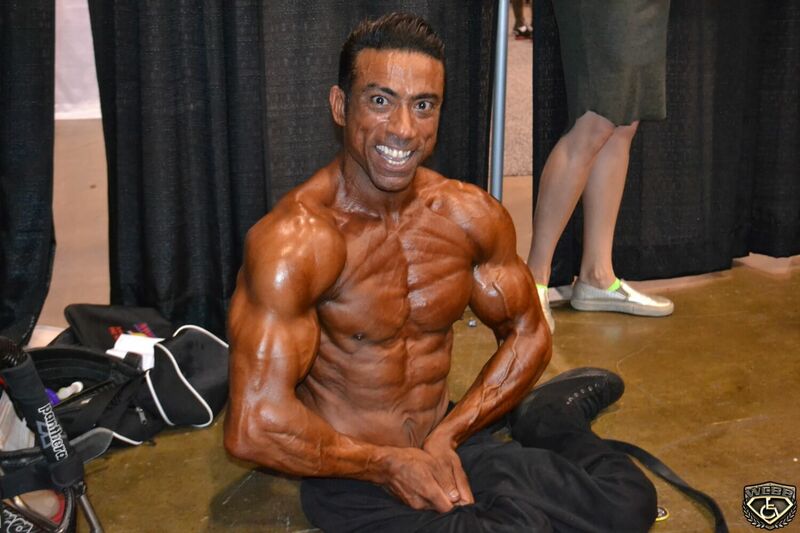 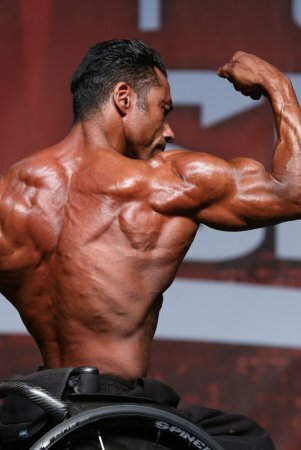 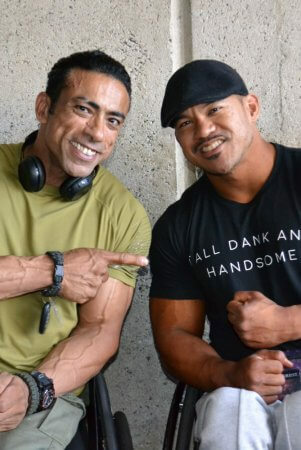 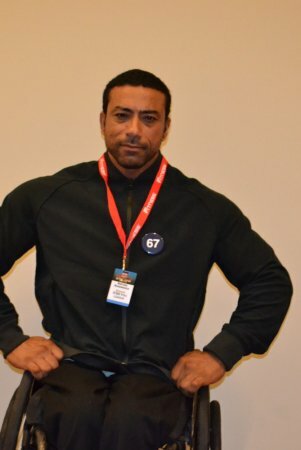 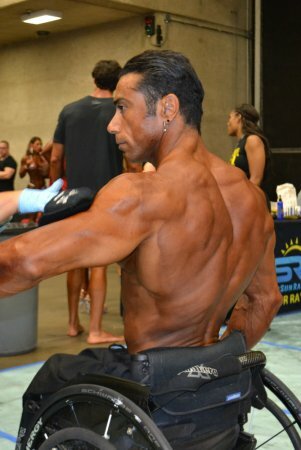 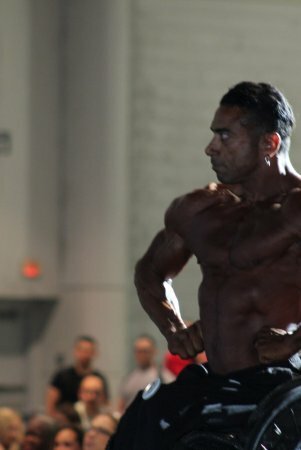 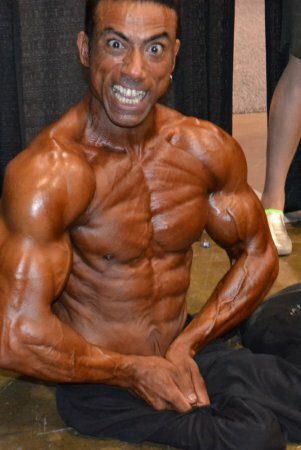 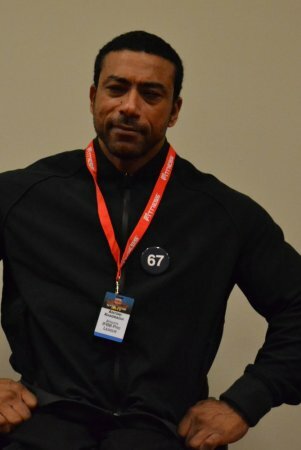 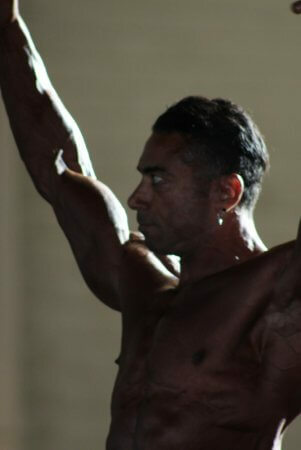 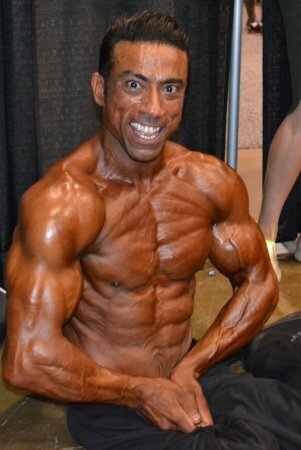 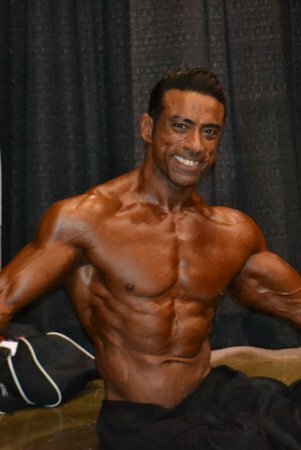 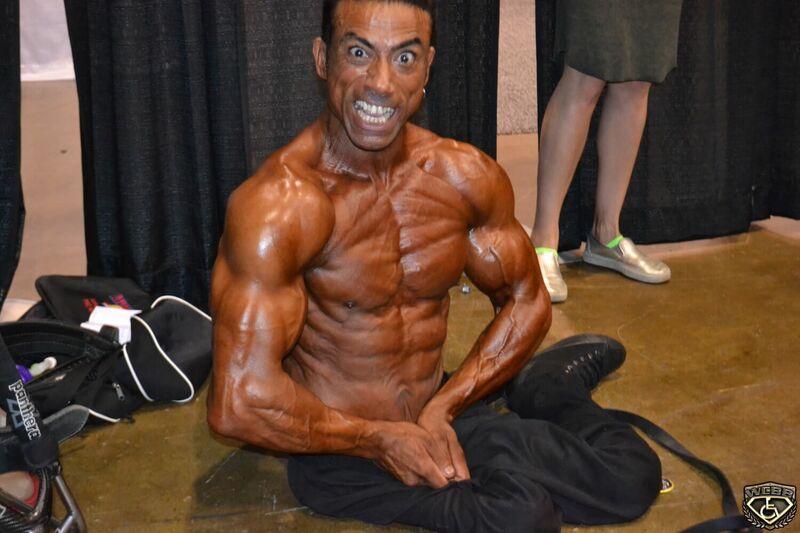 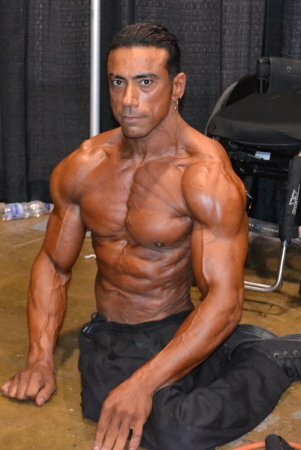 He chose to focus primarily on the bodybuilding techniques. His favorite workout routines are lats and dips in order to keep his body looking and feeling its best. 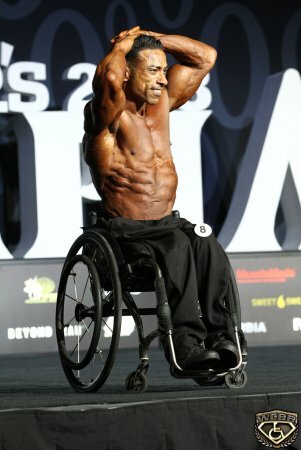 Although he still lifted the heavy weights, he chose to focus mainly on the efforts of bodybuilding. 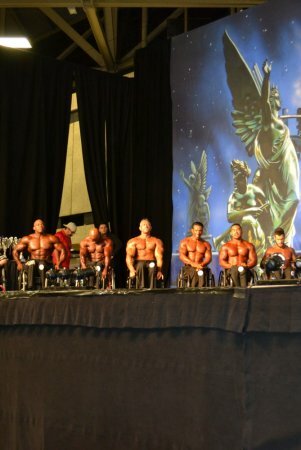 To him, it was mainly about the overall look of the bodybuilder as well as the bodybuilding lifestyle. 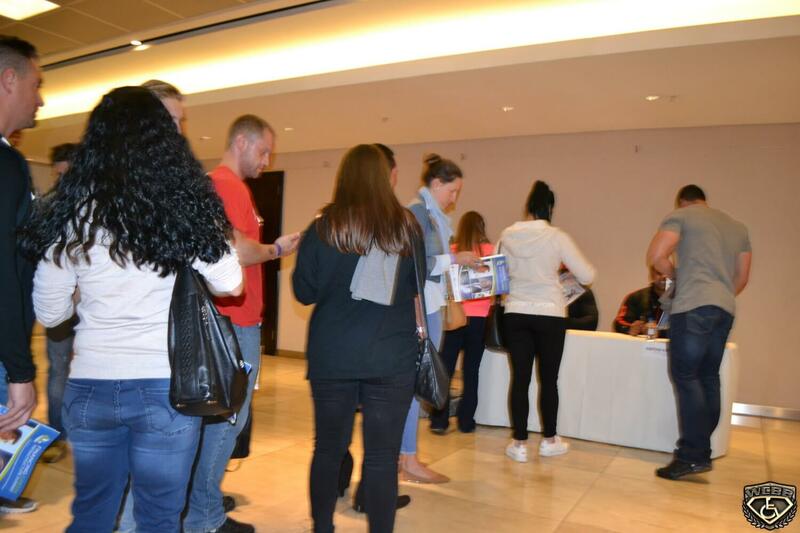 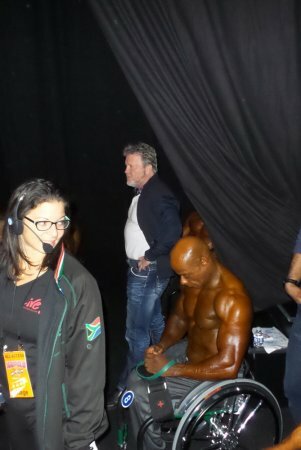 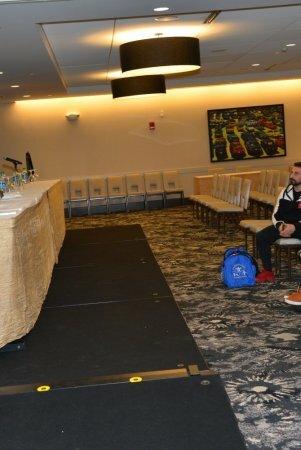 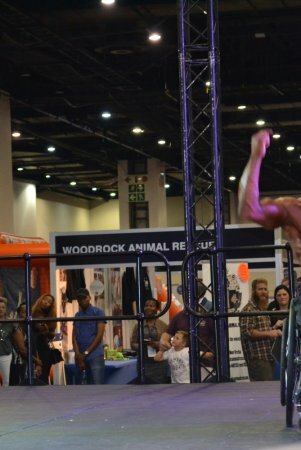 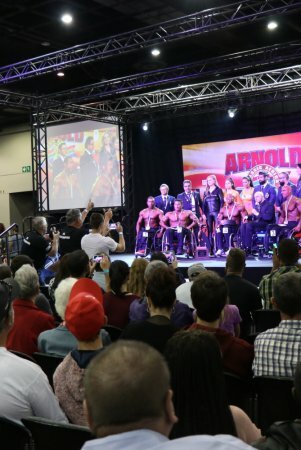 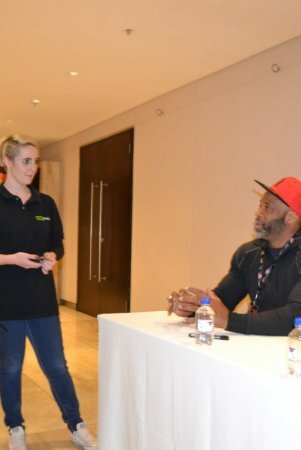 Antoni was approached by a promoter that asked him to do a bodybuilding show which would consist of an audience of about 5000 people or more. 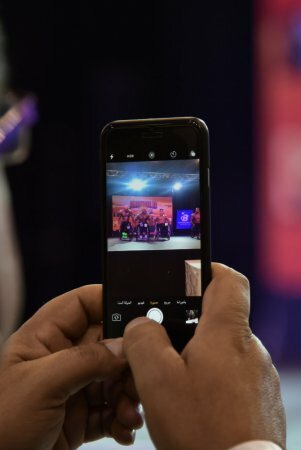 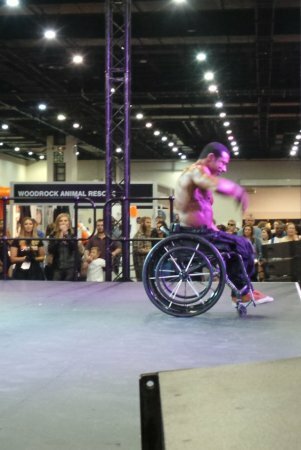 He gladly accepted the invitation and performed for the very large crowd. 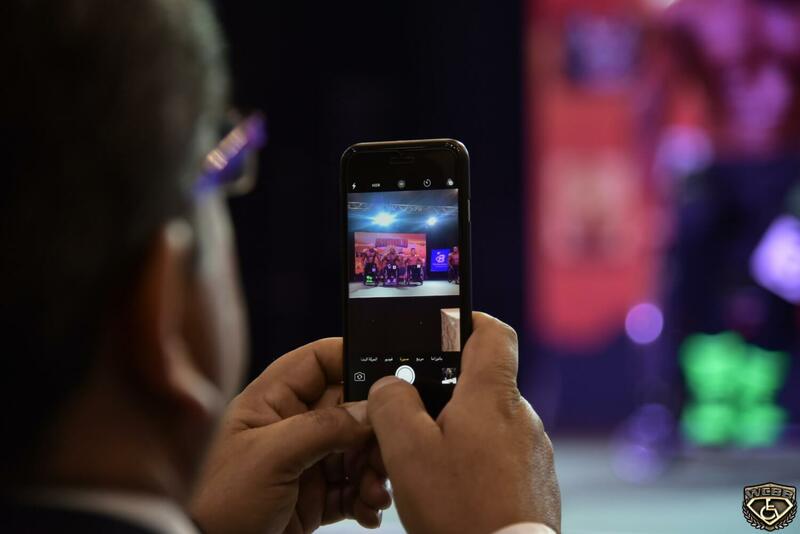 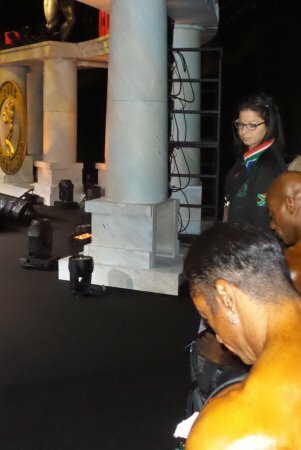 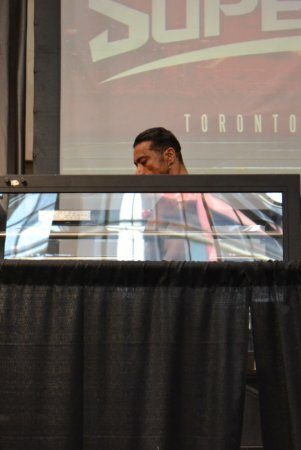 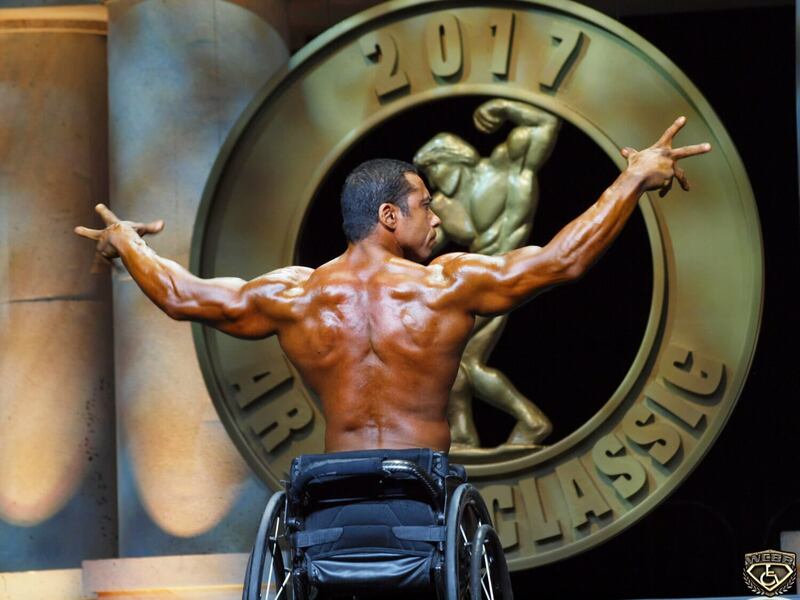 People in the audience were amazed as well as impressed not only by his strength but also by his dedication and discipline. 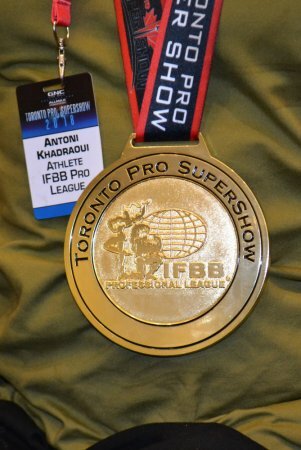 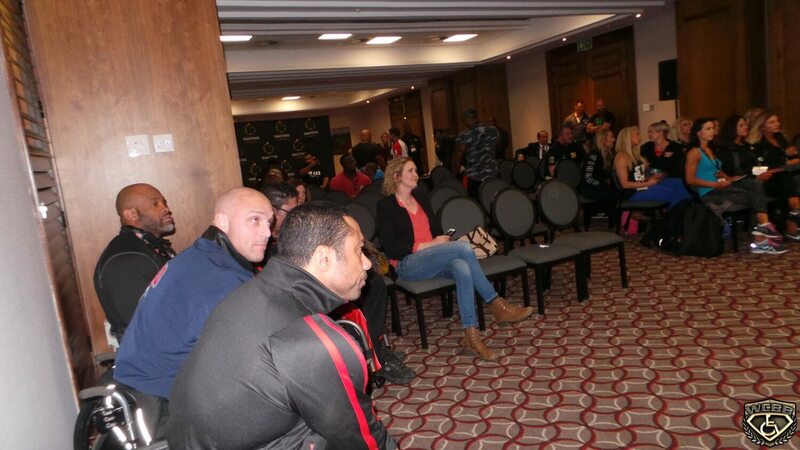 On the very same day of his performance, the promoter issued Antoni a license for competition in SKKF. 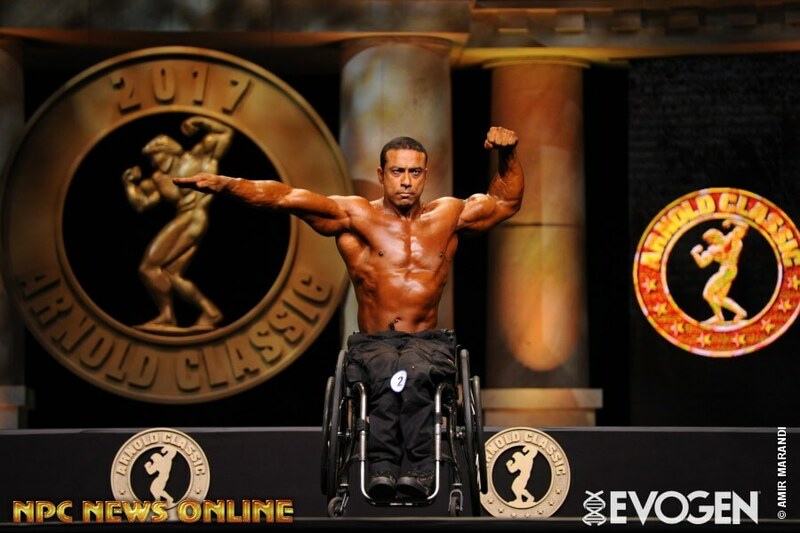 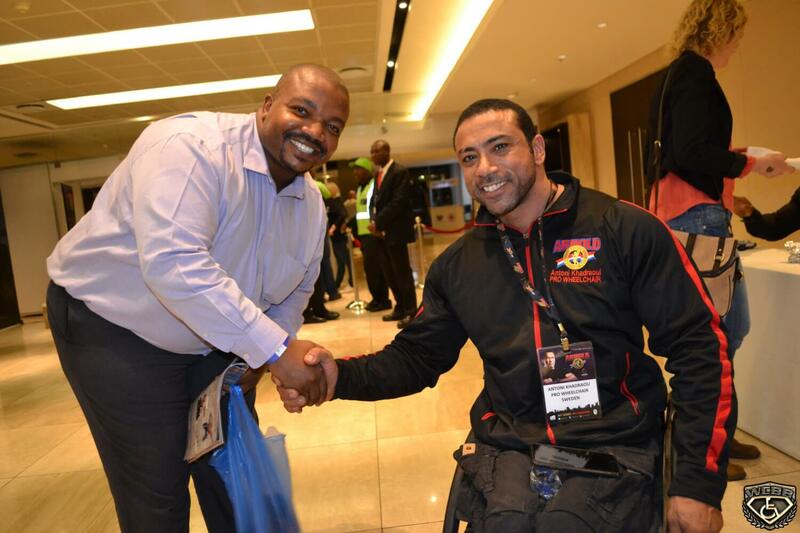 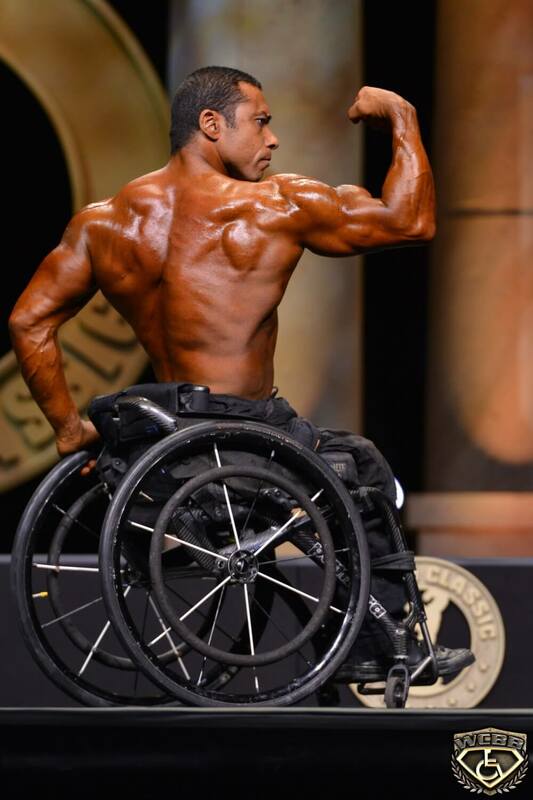 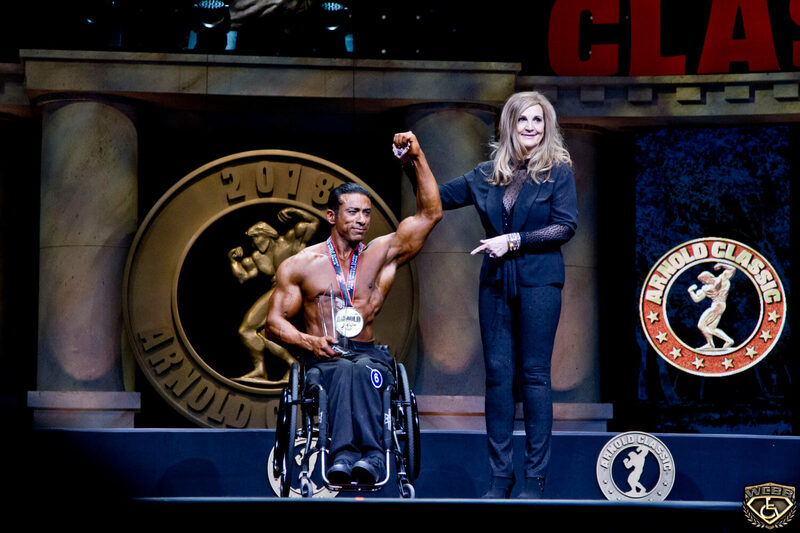 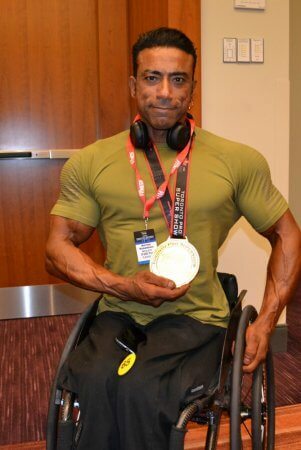 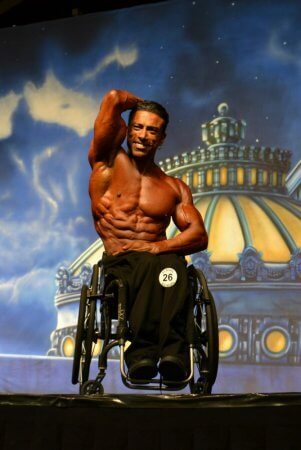 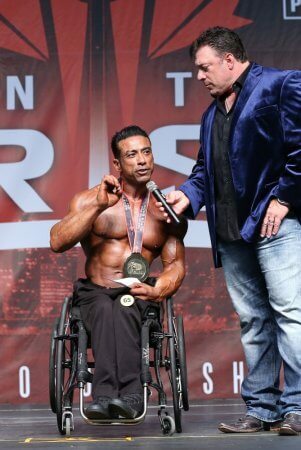 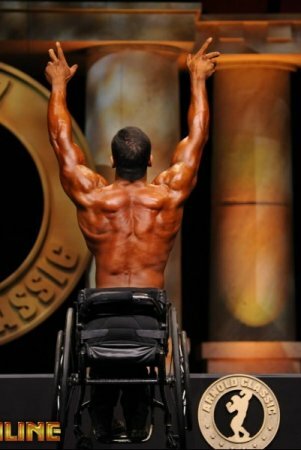 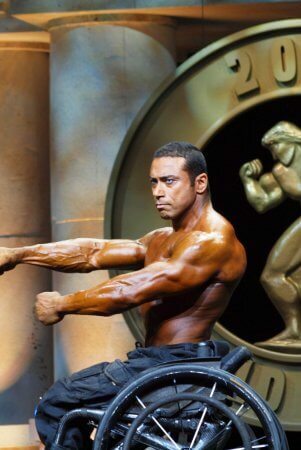 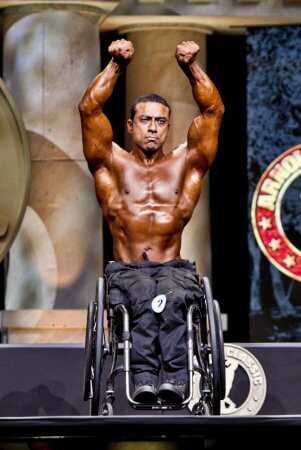 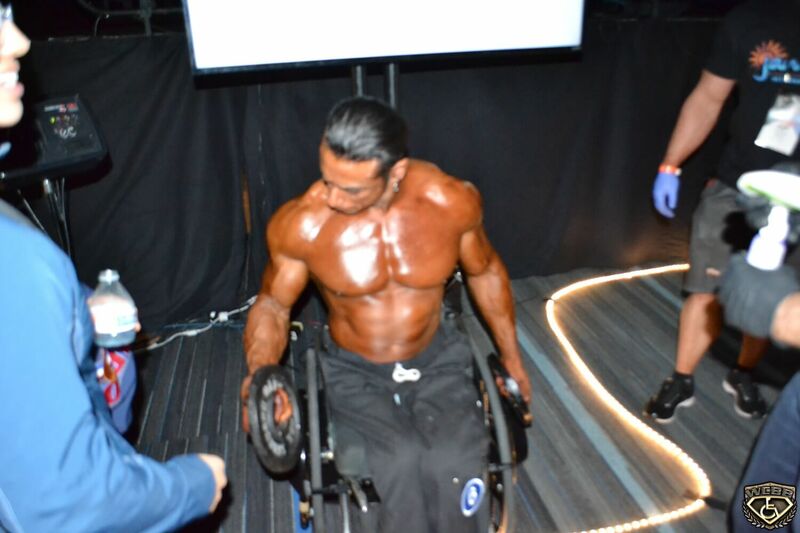 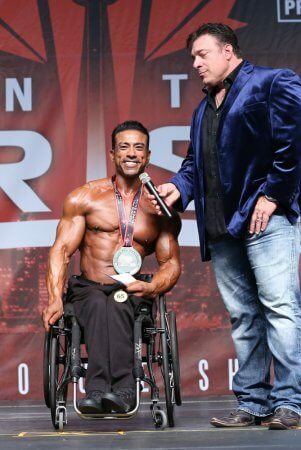 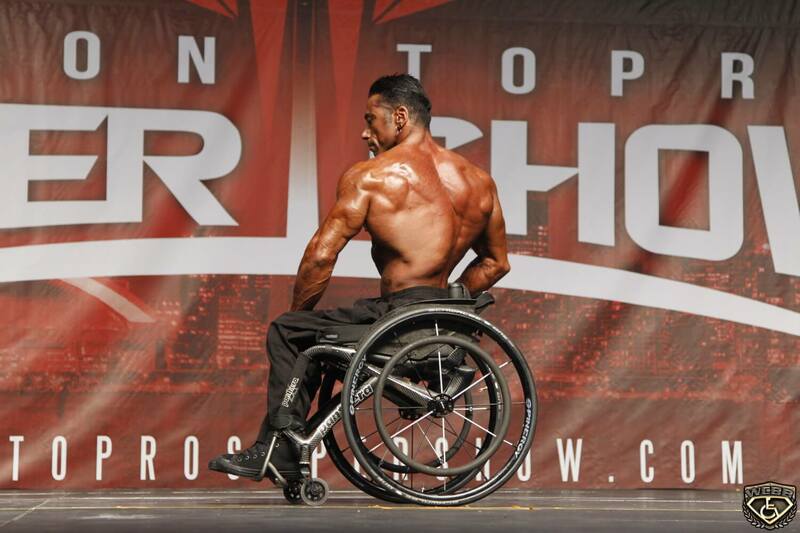 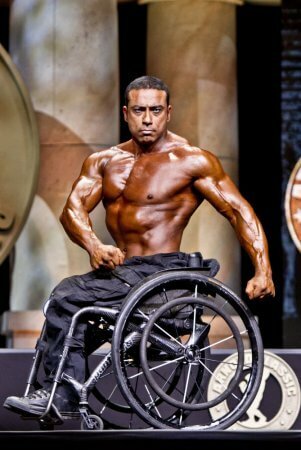 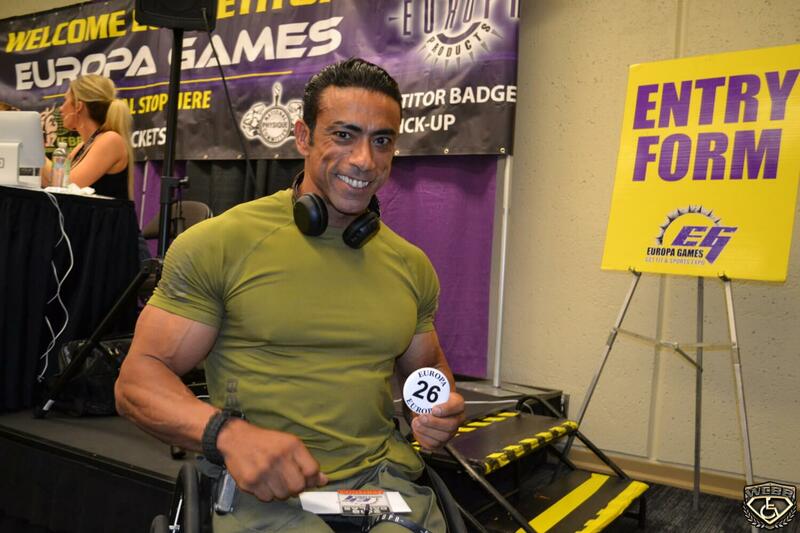 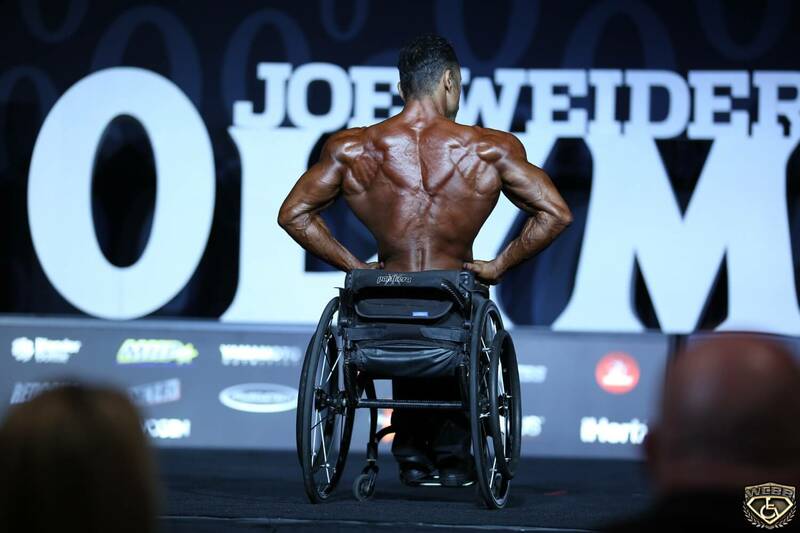 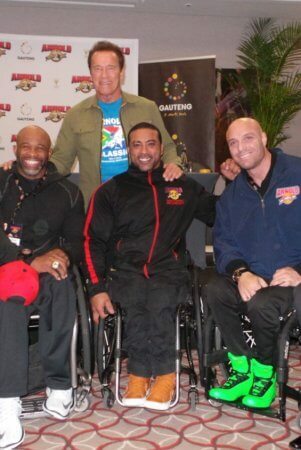 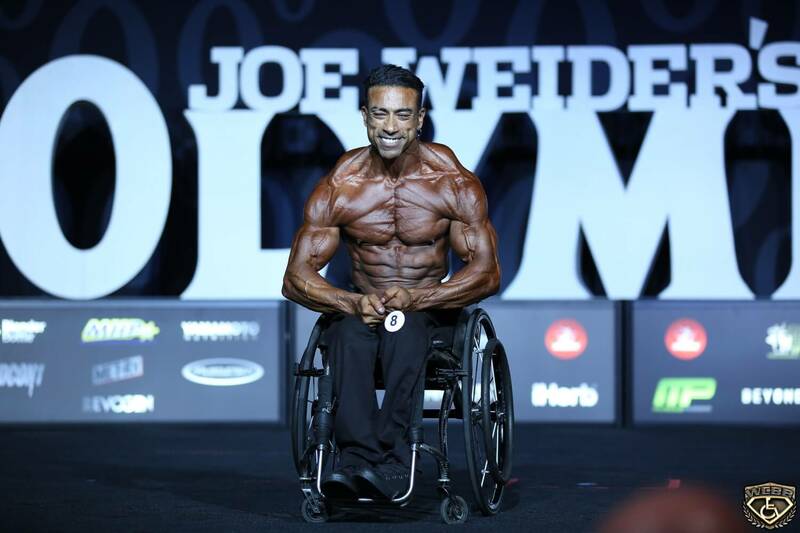 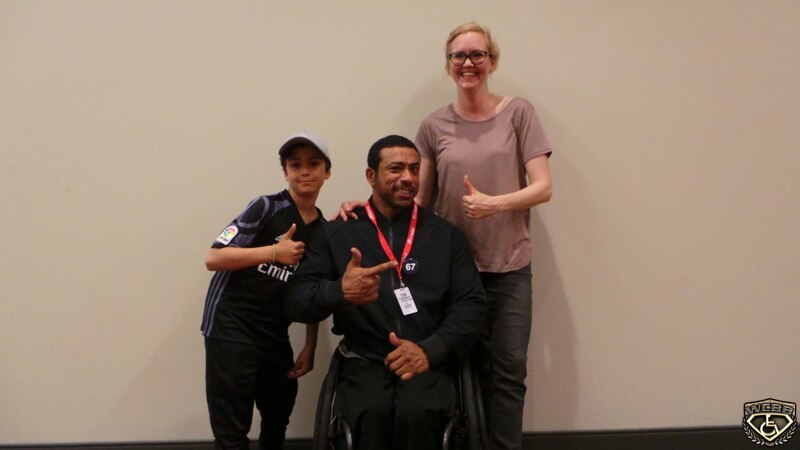 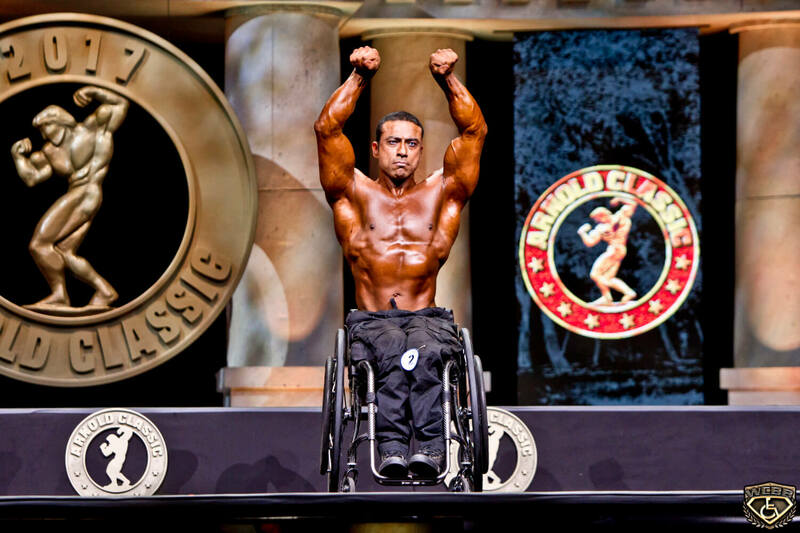 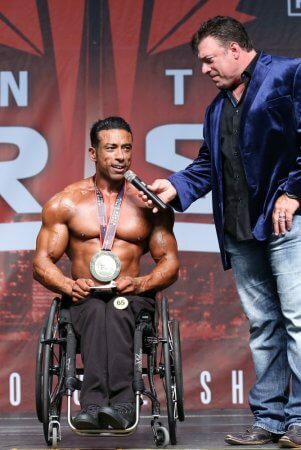 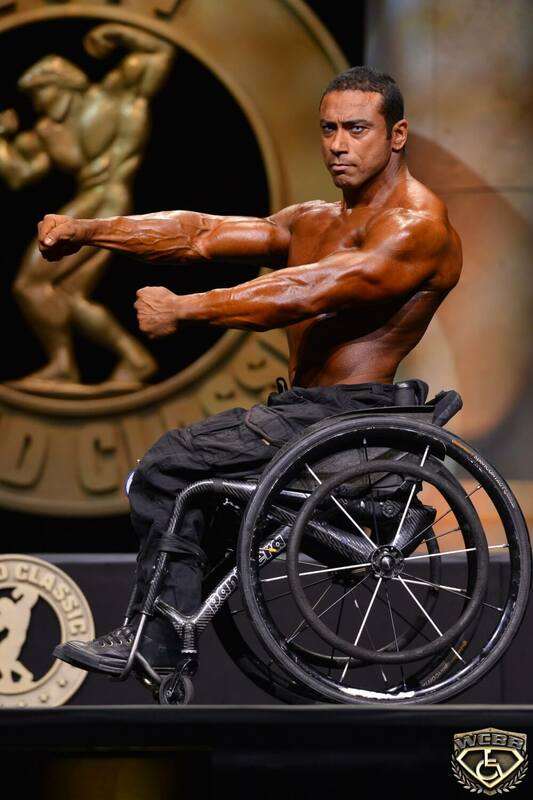 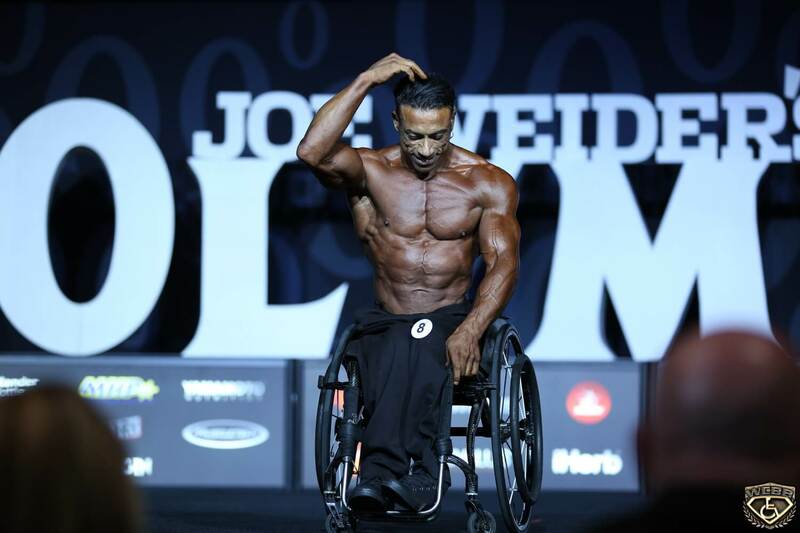 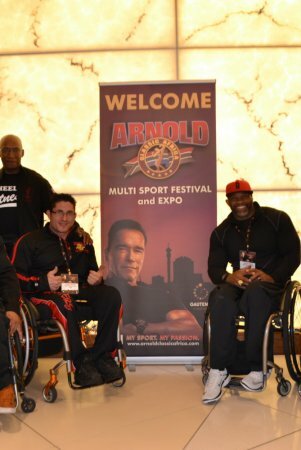 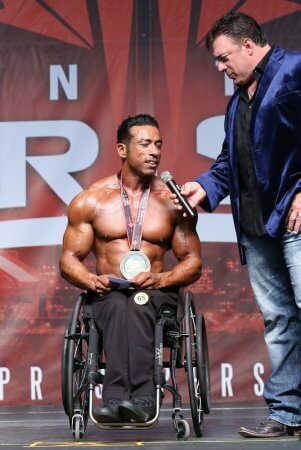 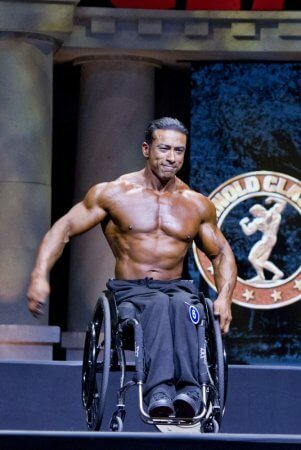 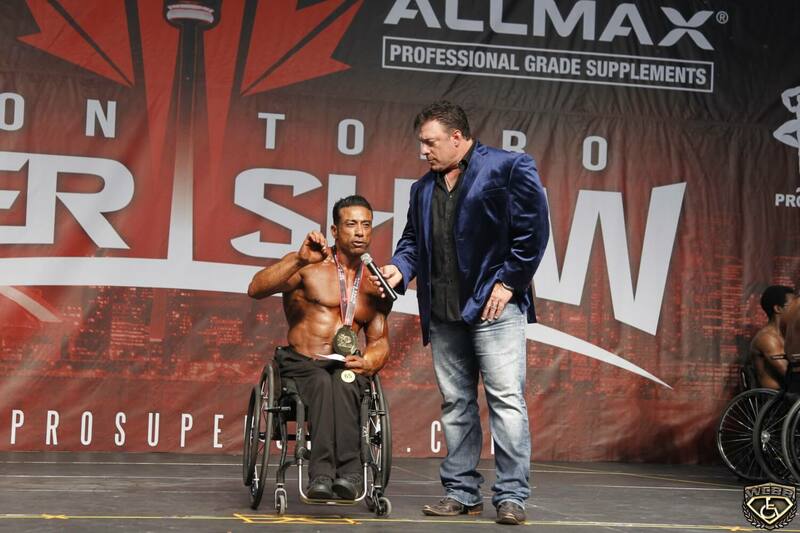 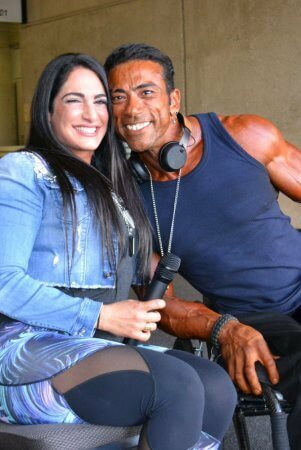 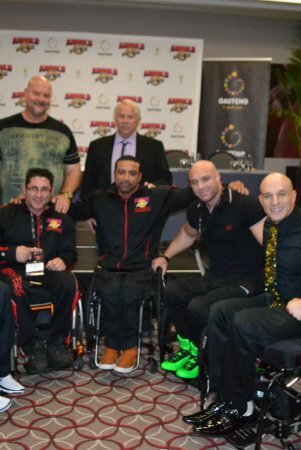 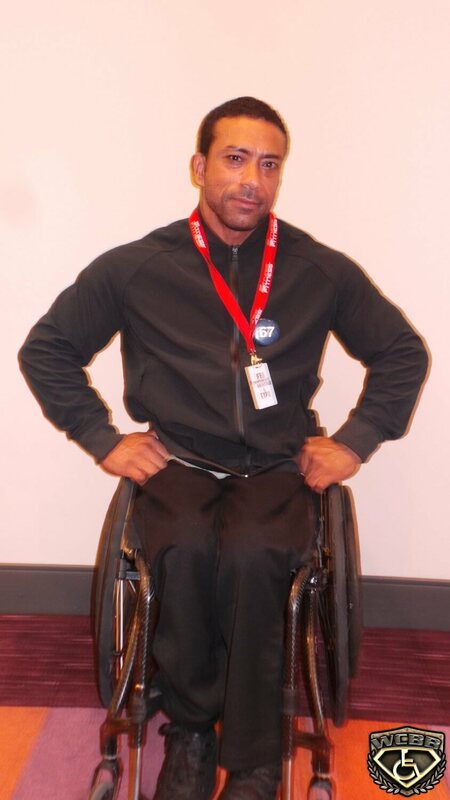 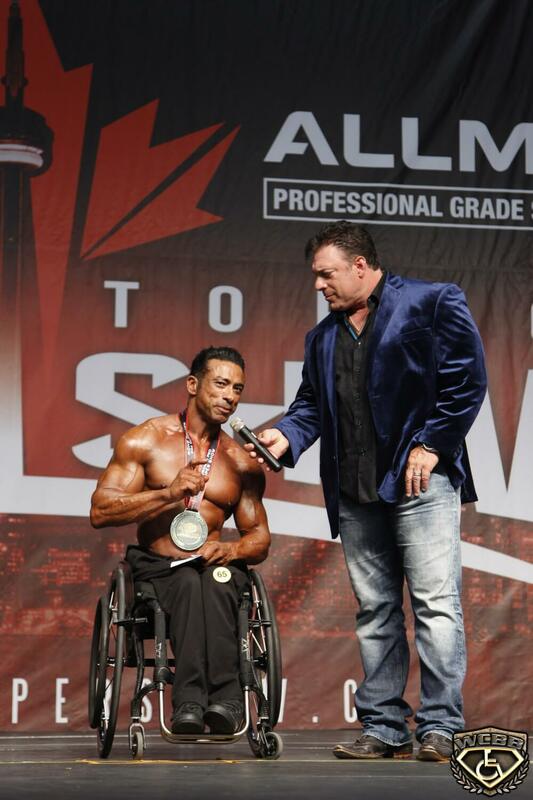 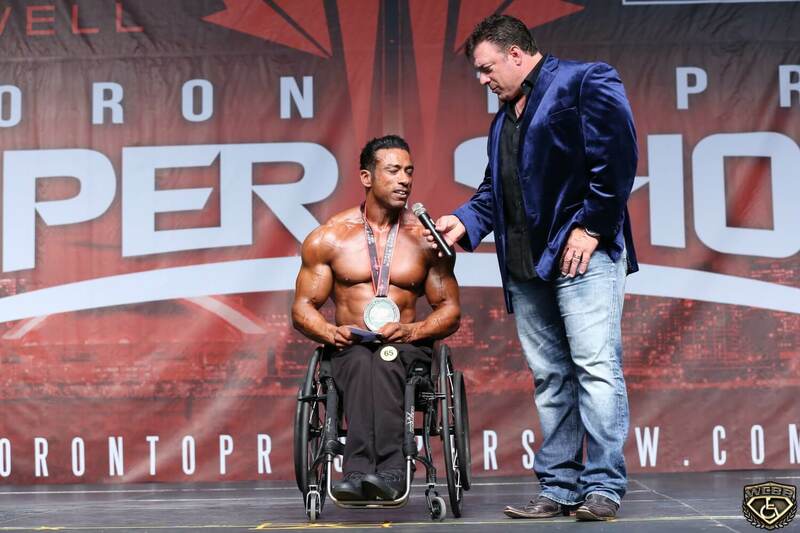 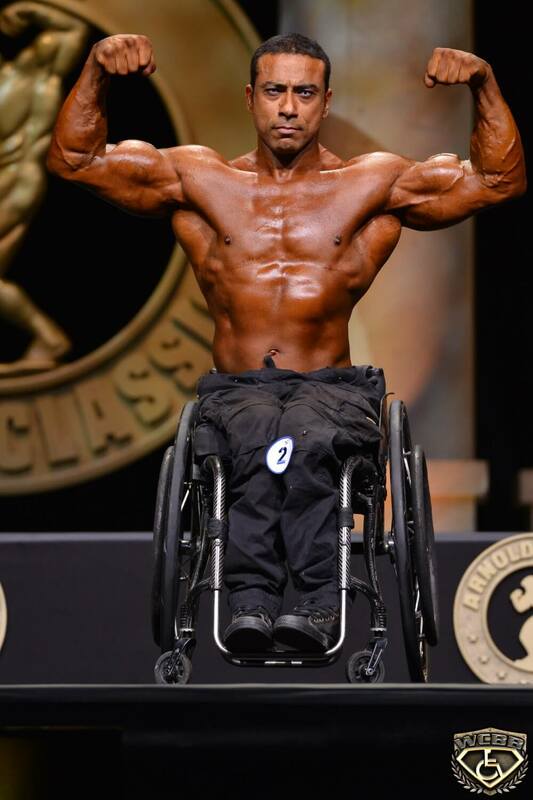 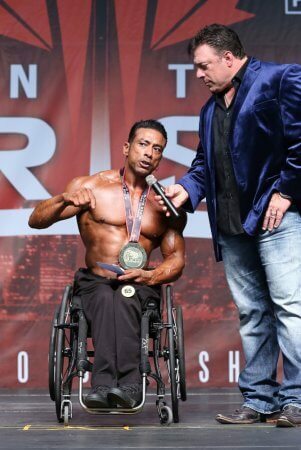 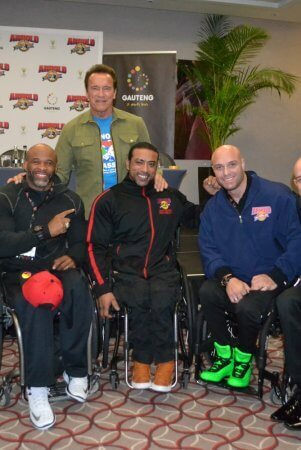 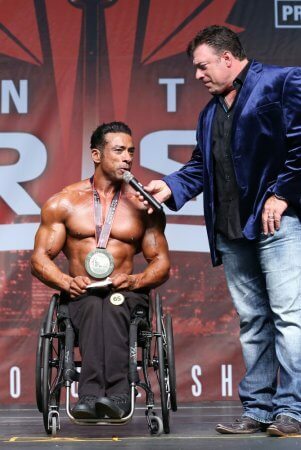 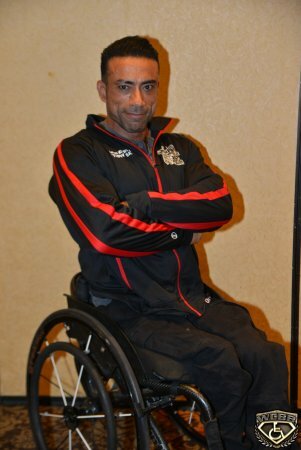 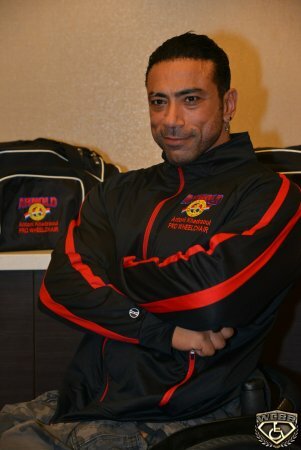 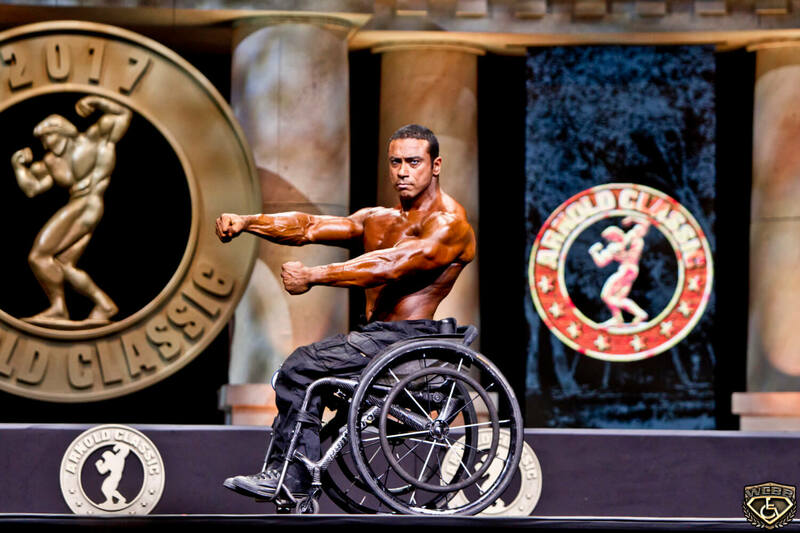 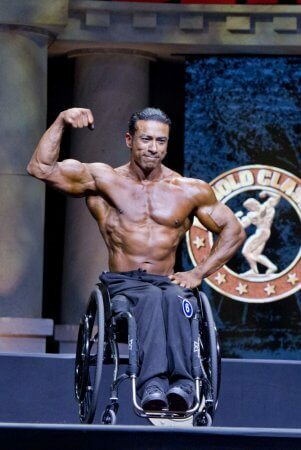 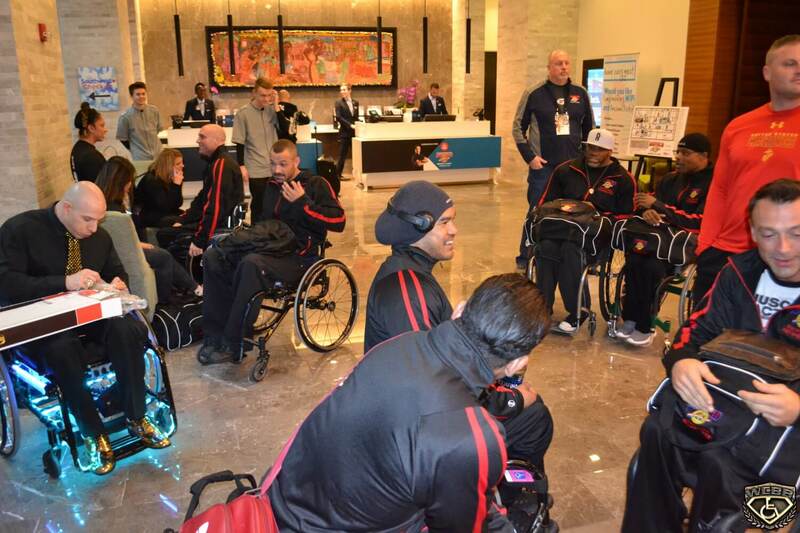 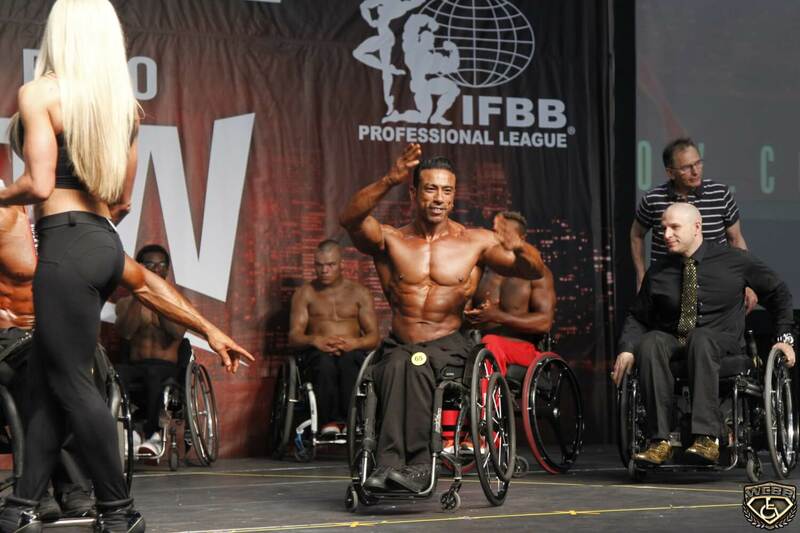 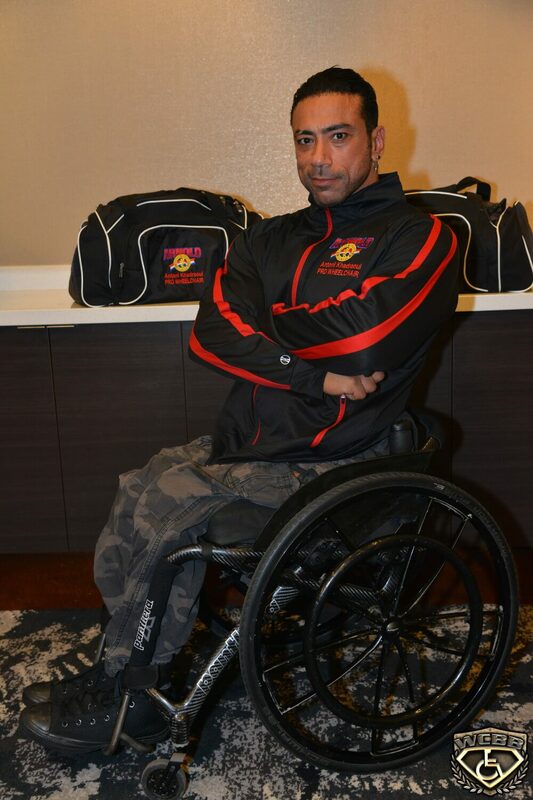 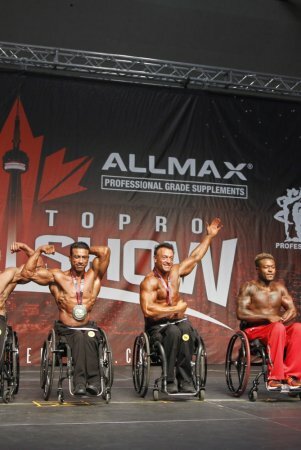 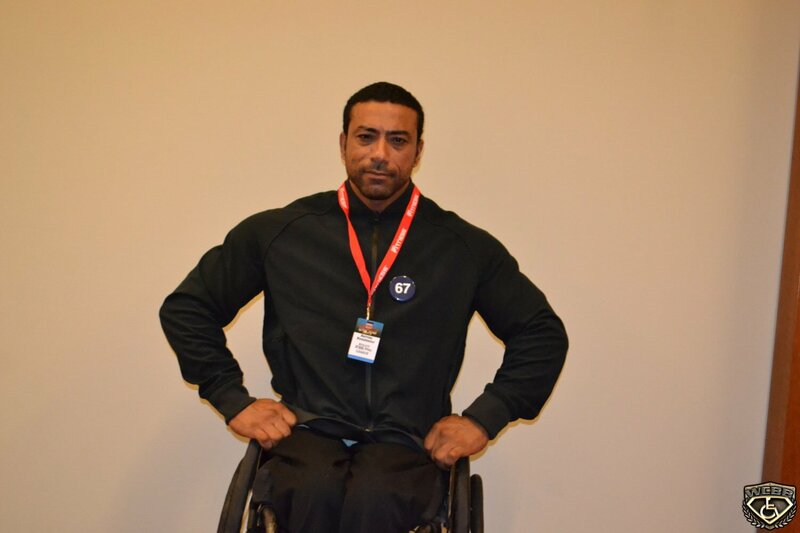 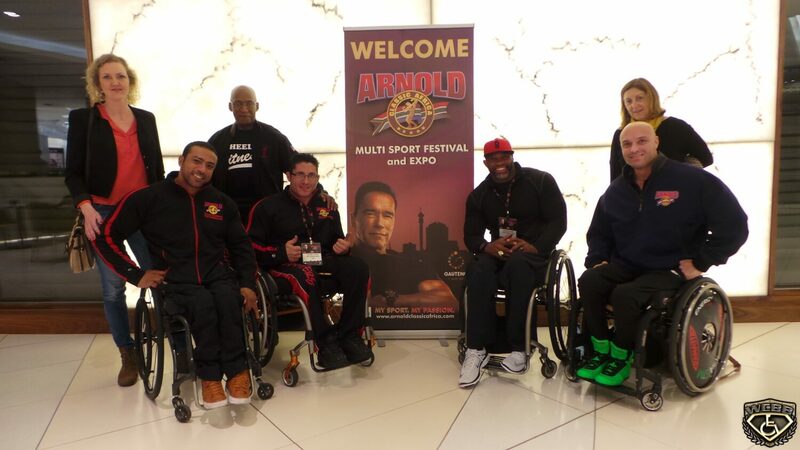 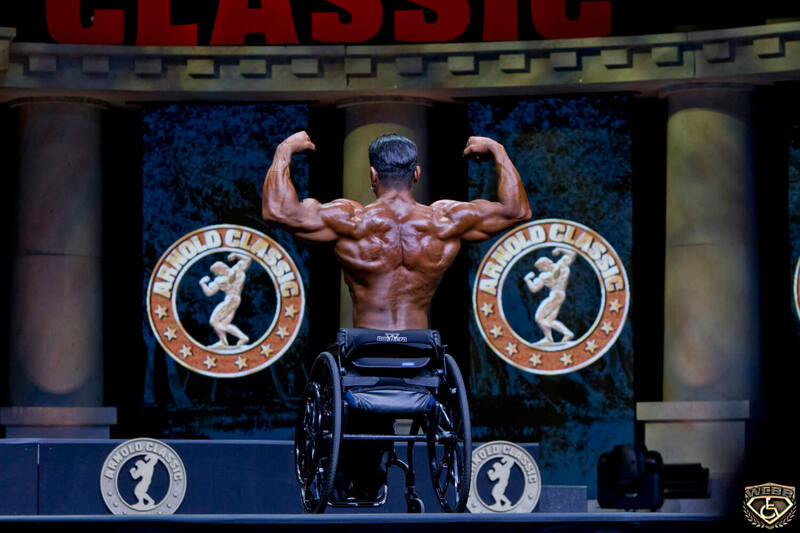 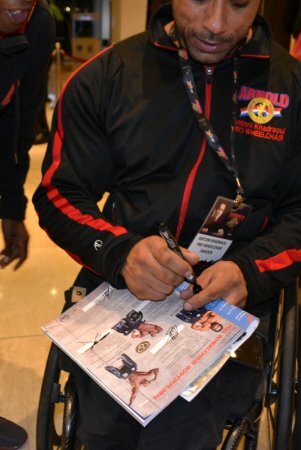 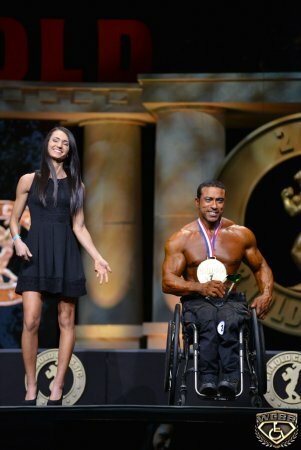 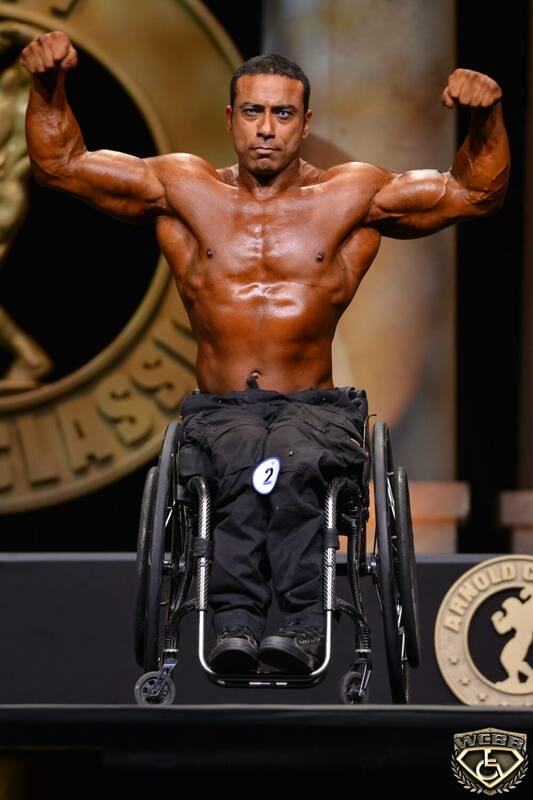 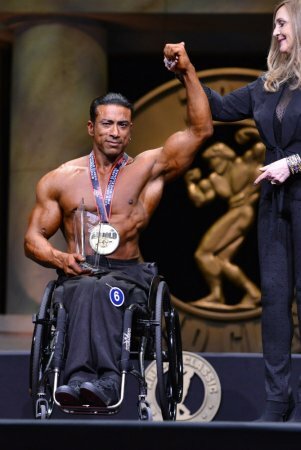 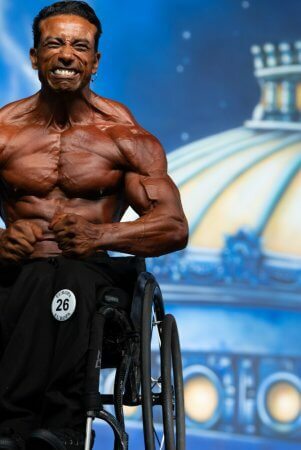 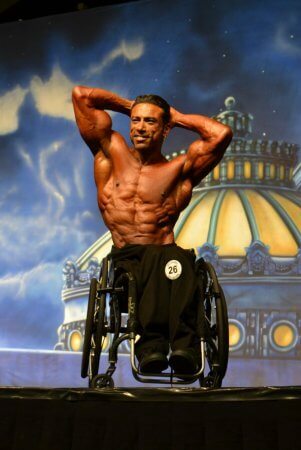 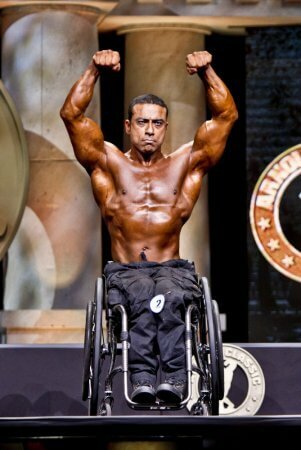 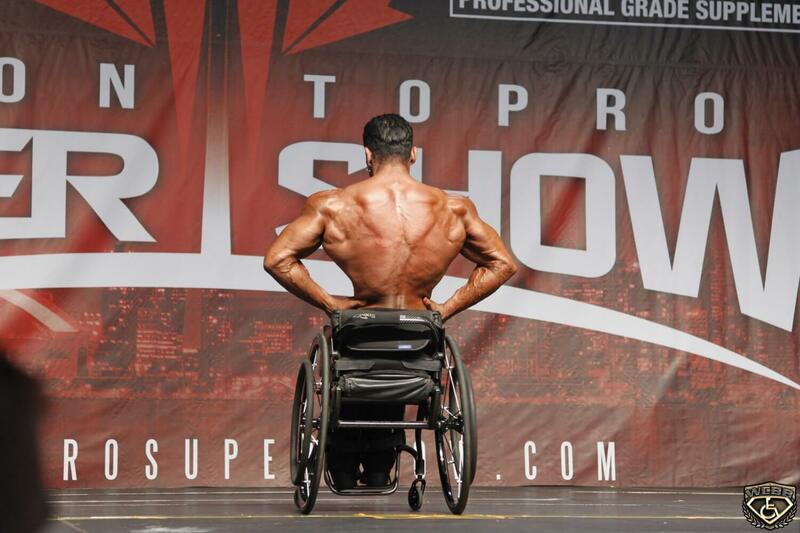 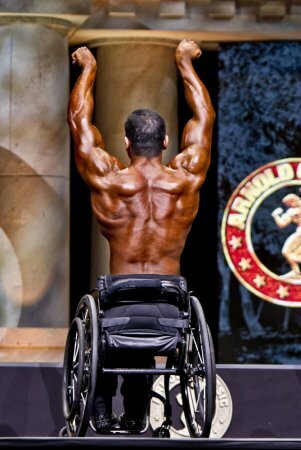 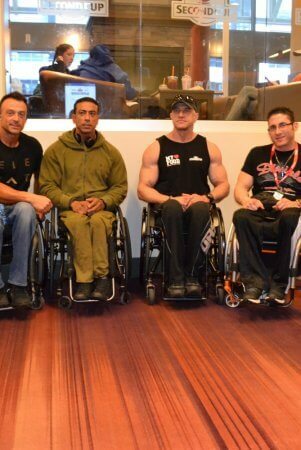 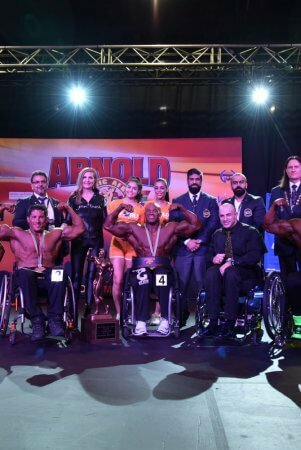 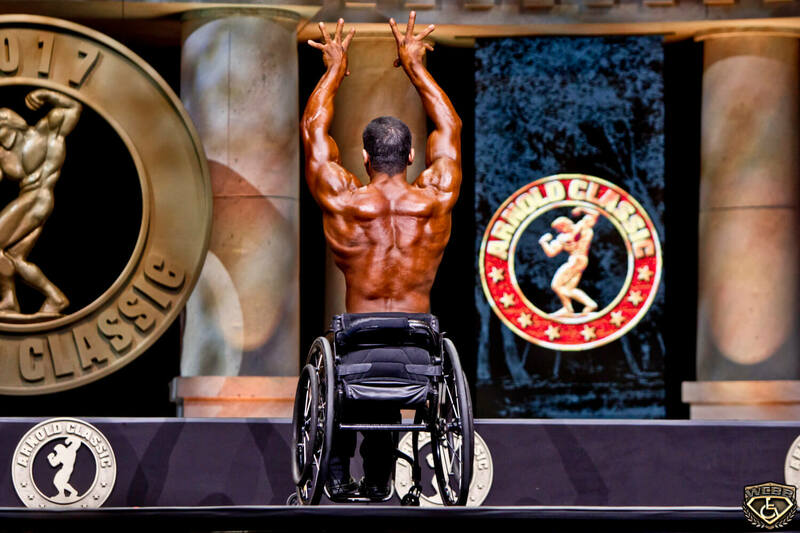 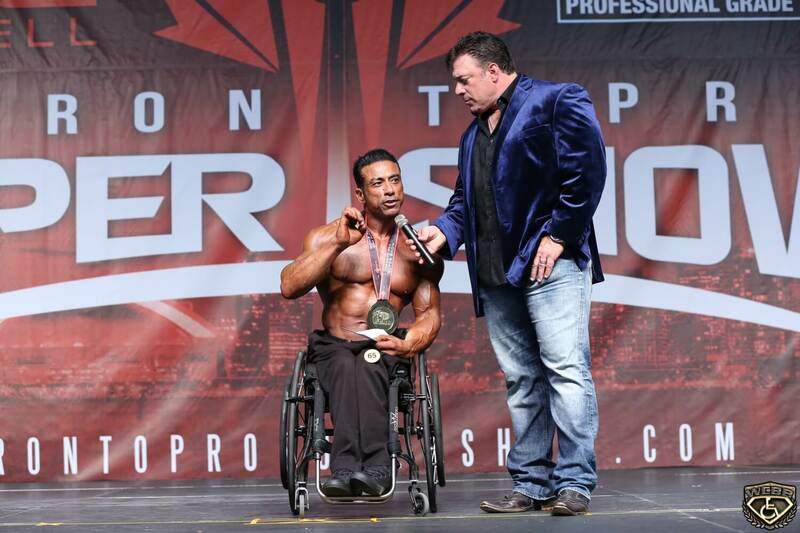 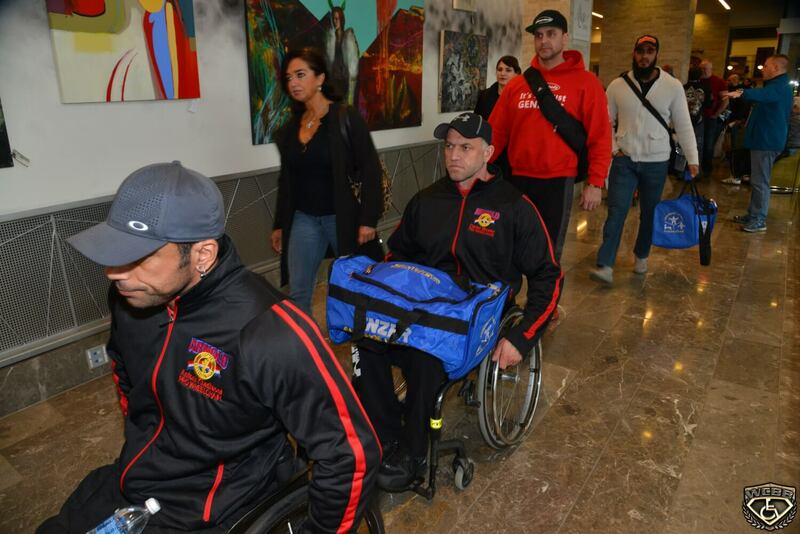 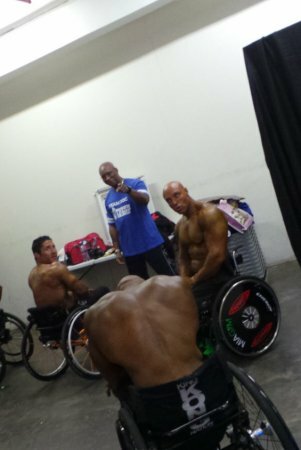 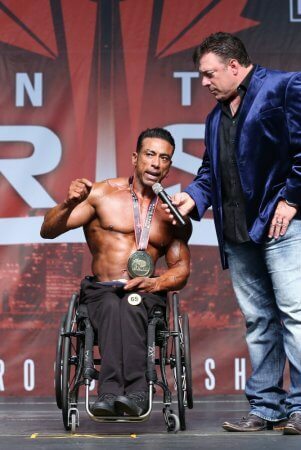 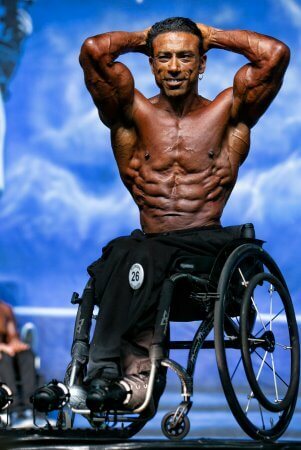 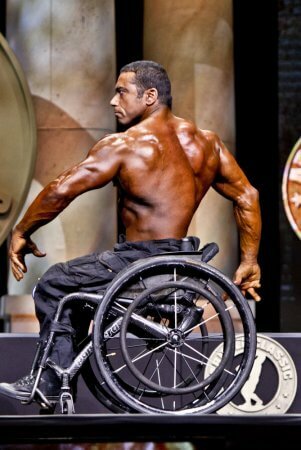 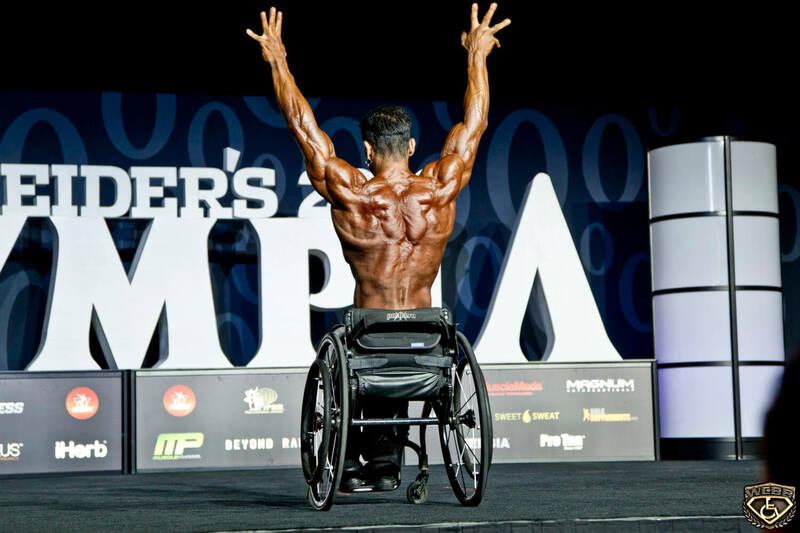 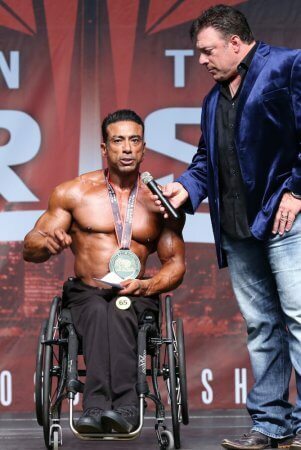 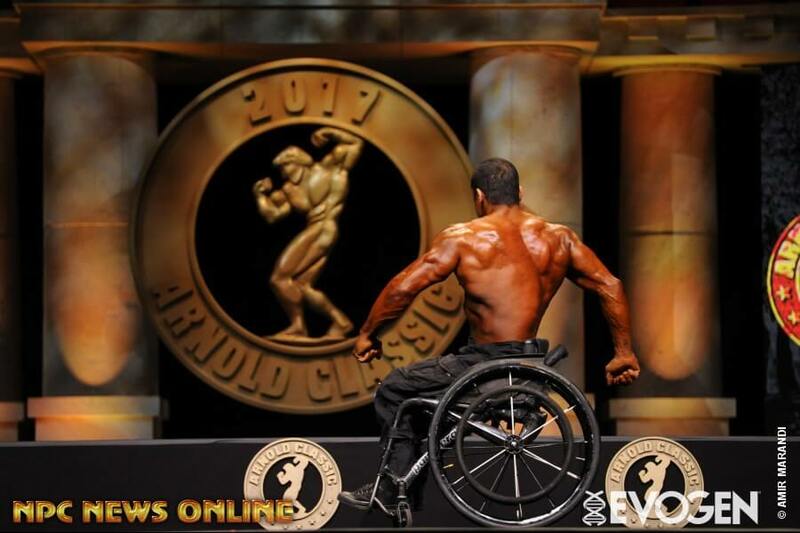 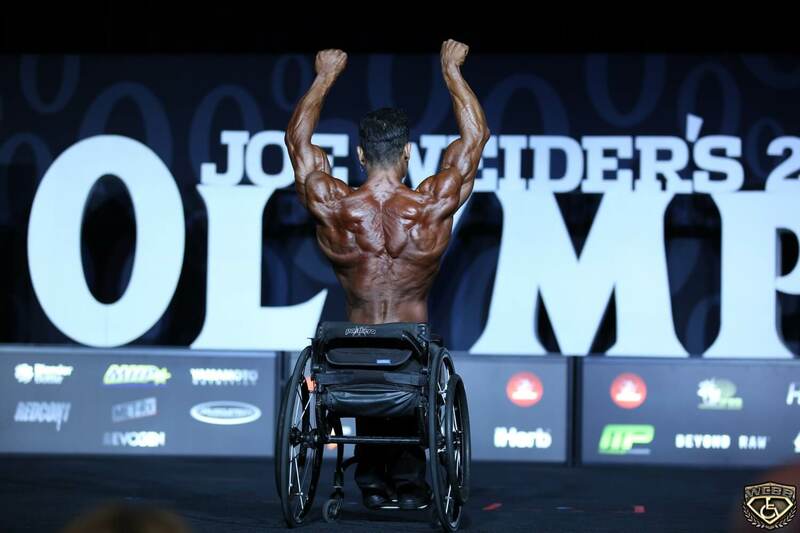 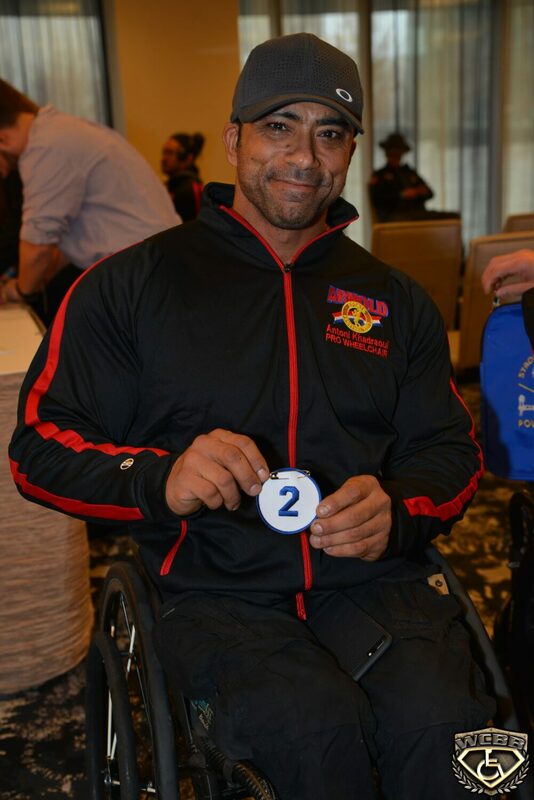 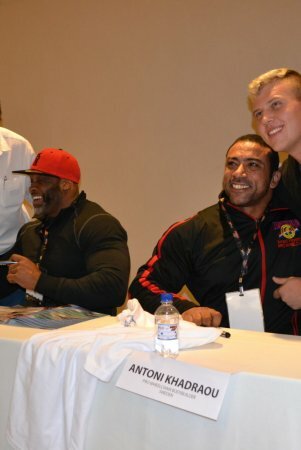 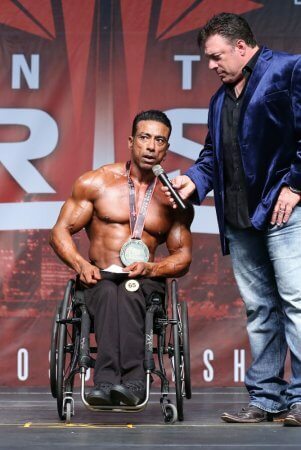 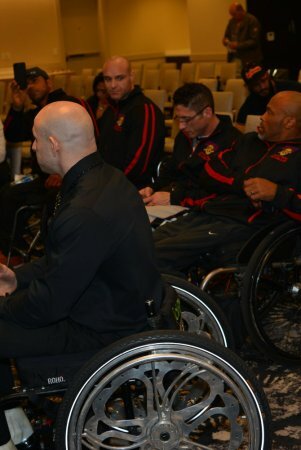 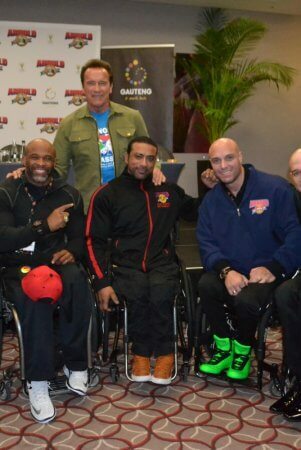 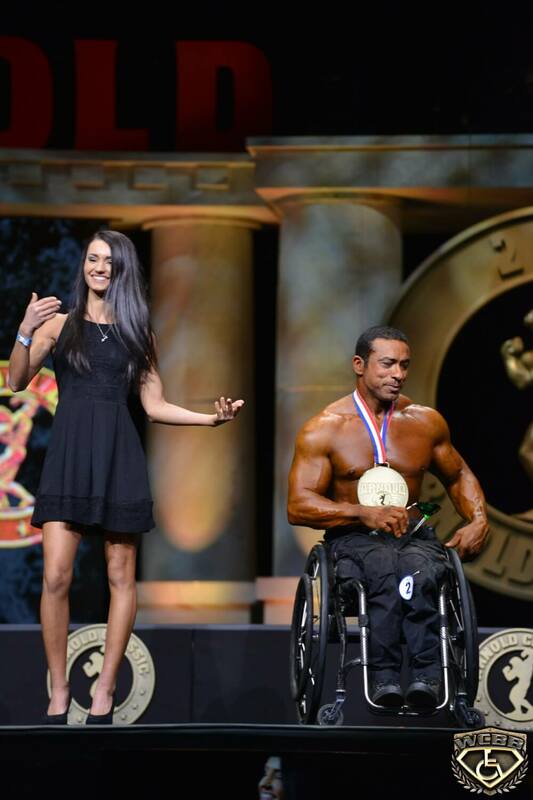 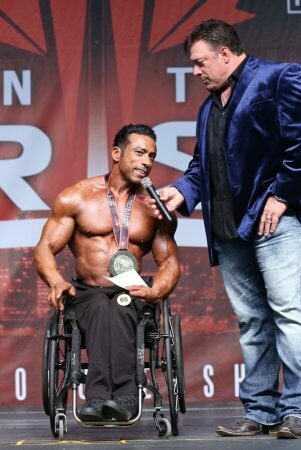 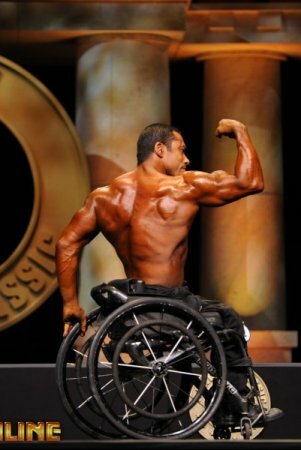 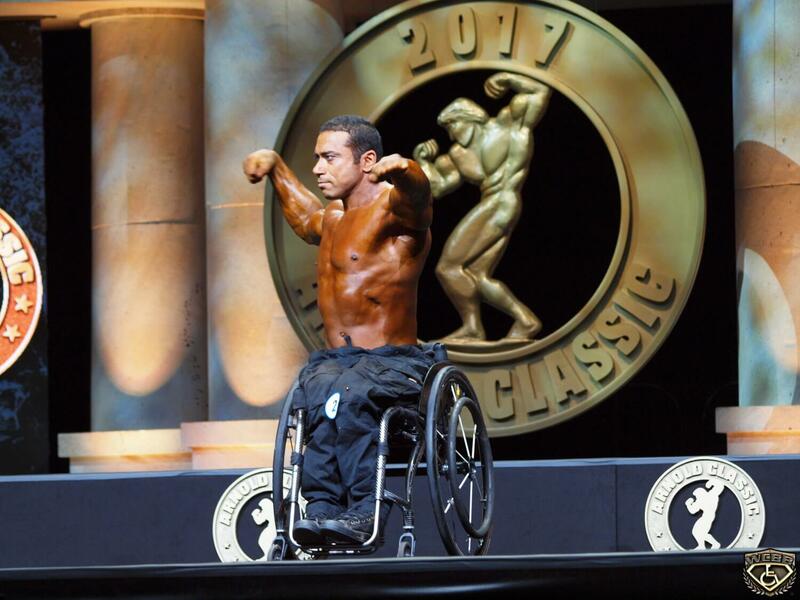 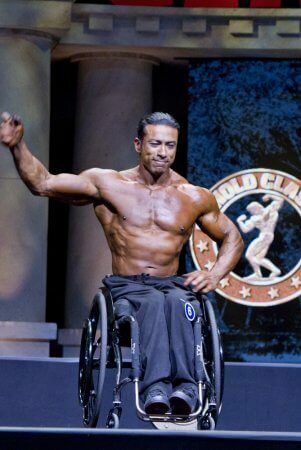 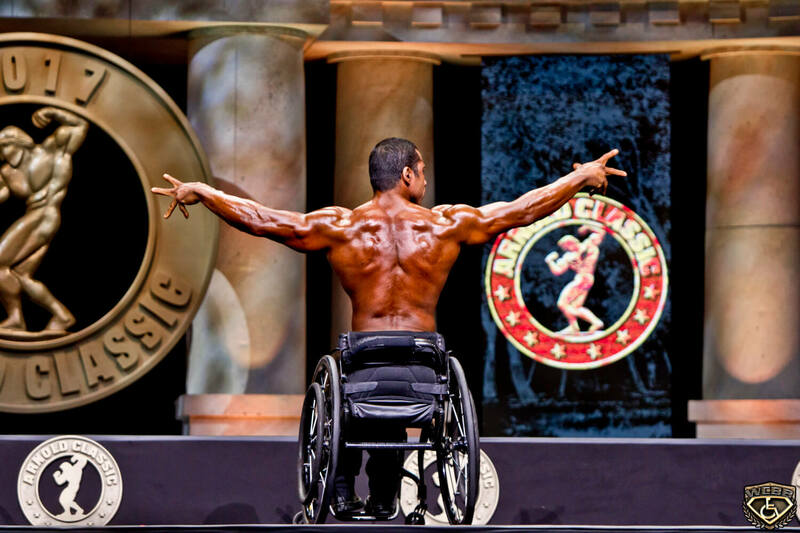 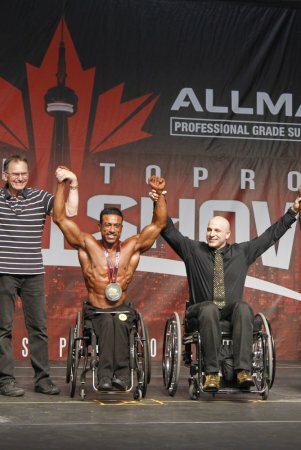 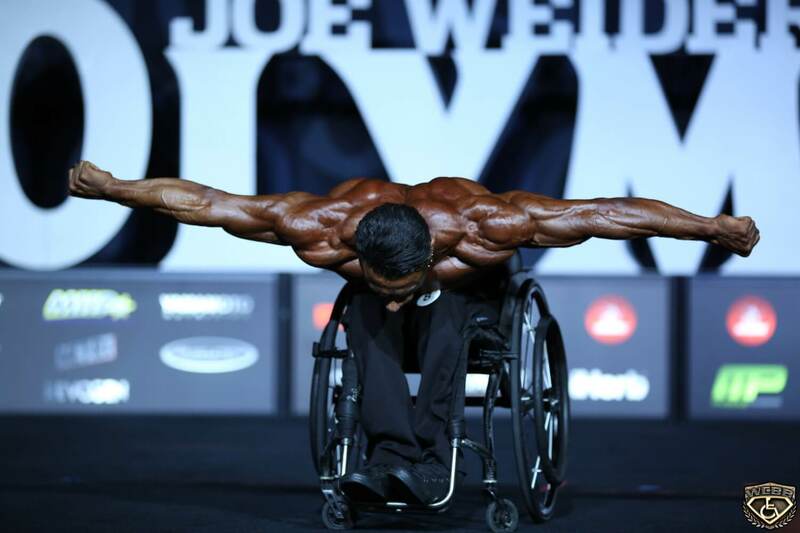 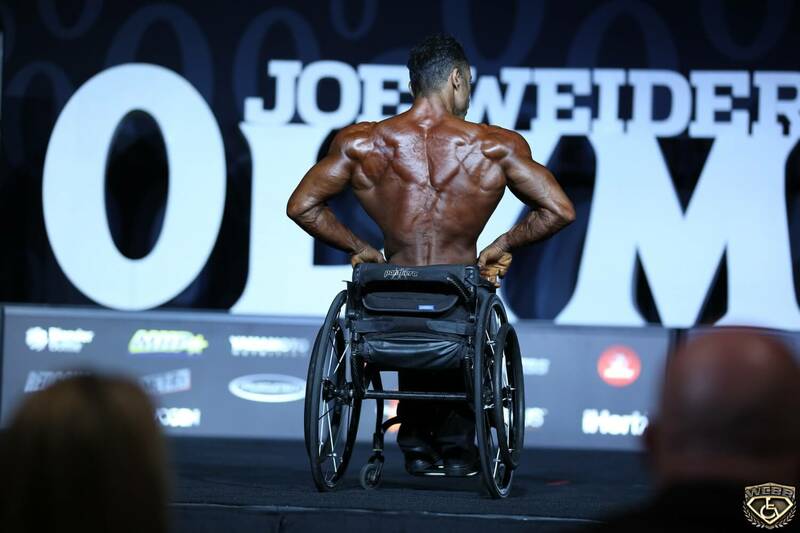 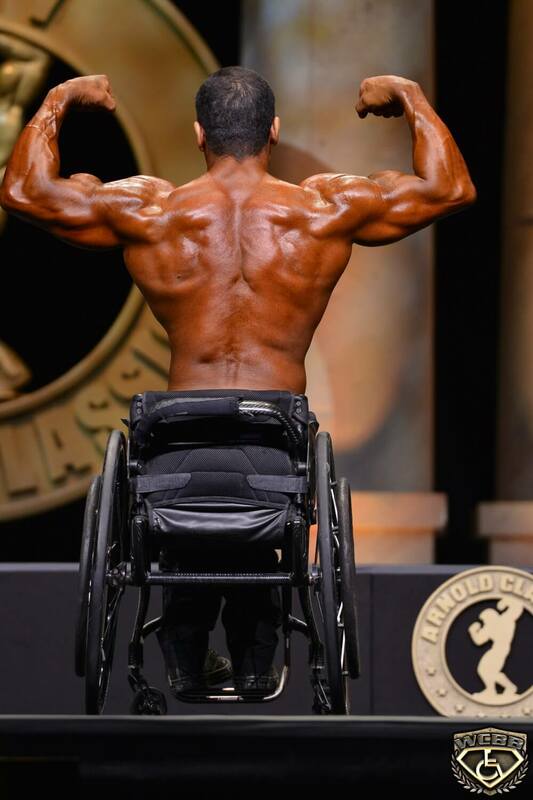 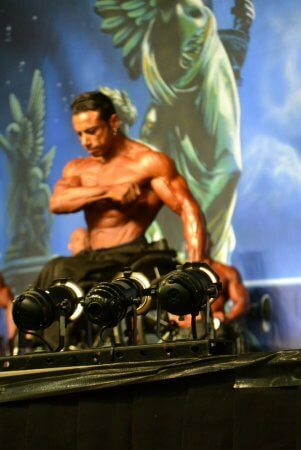 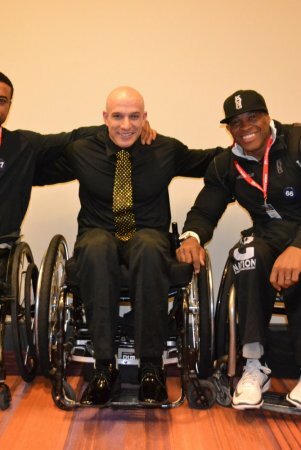 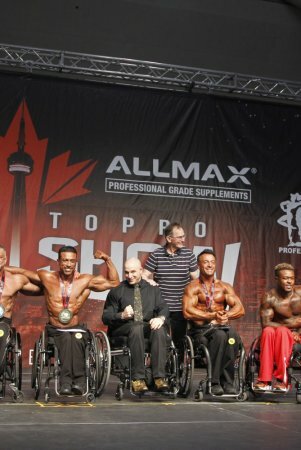 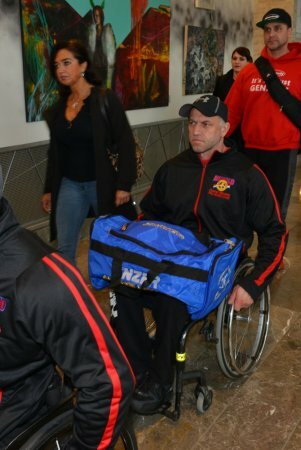 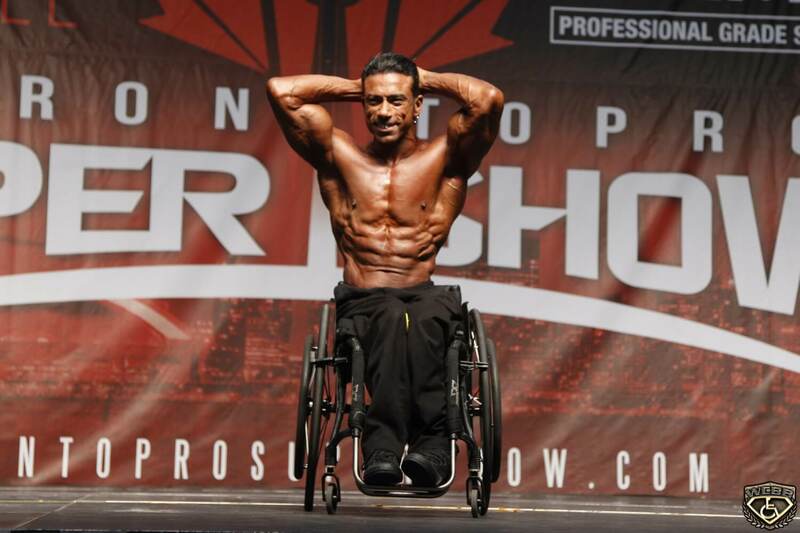 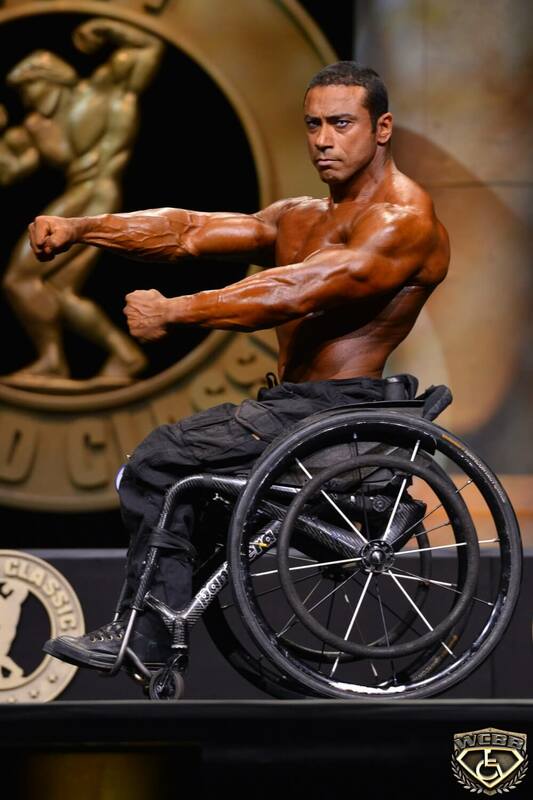 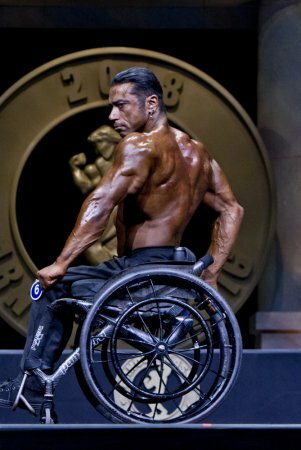 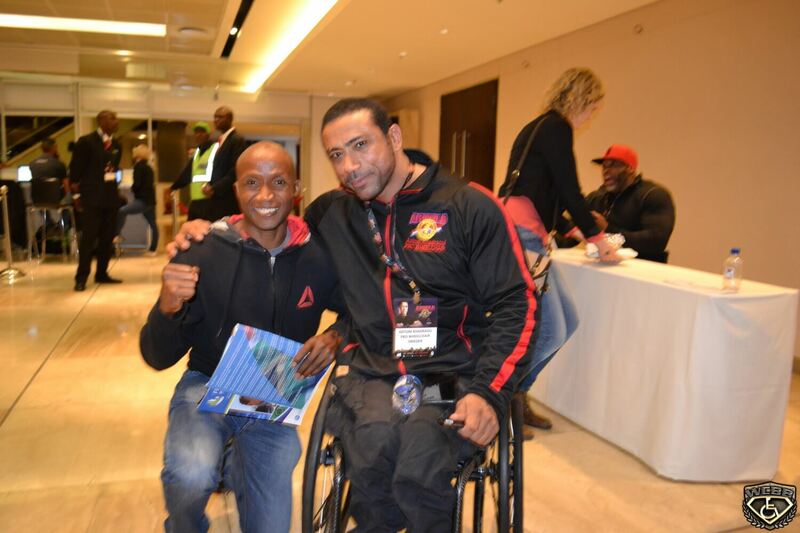 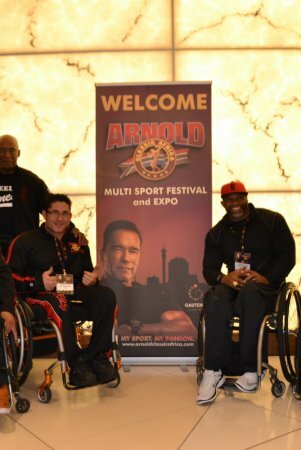 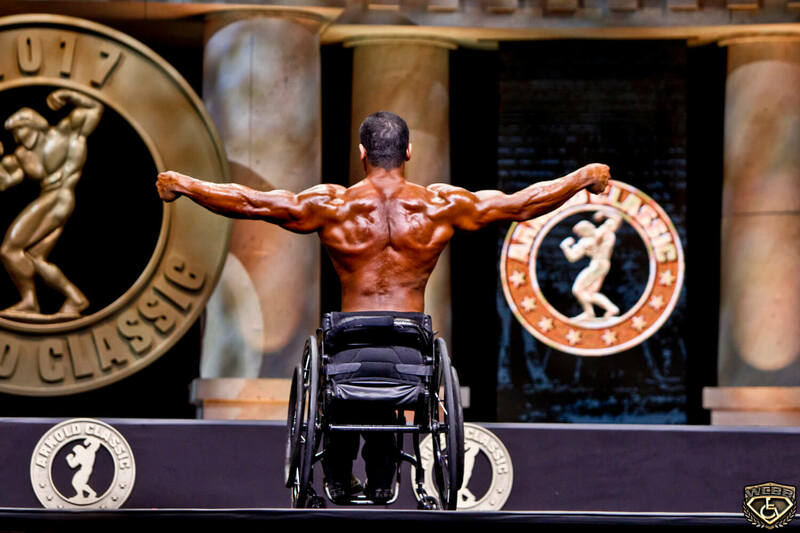 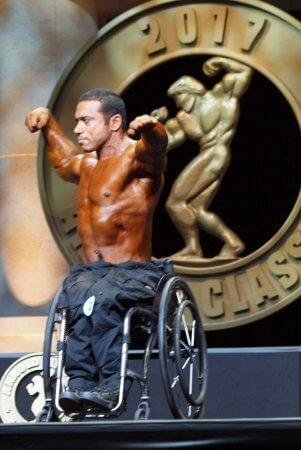 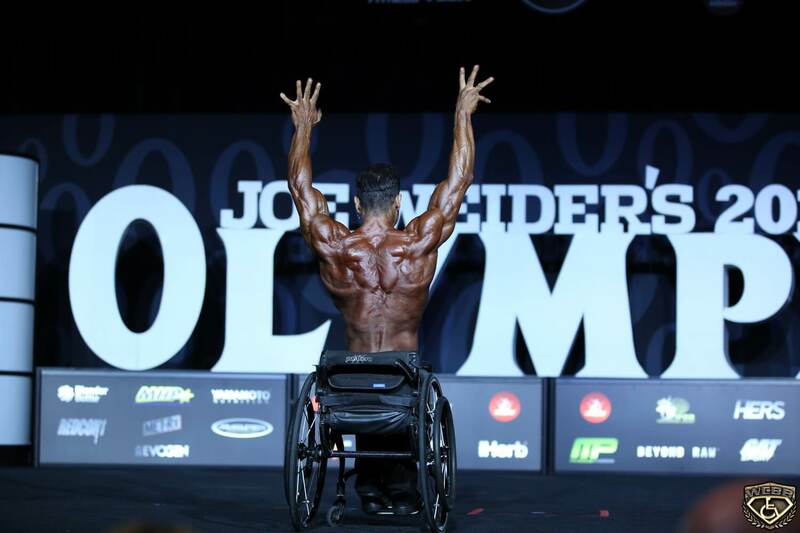 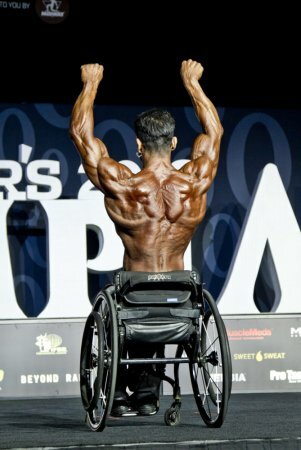 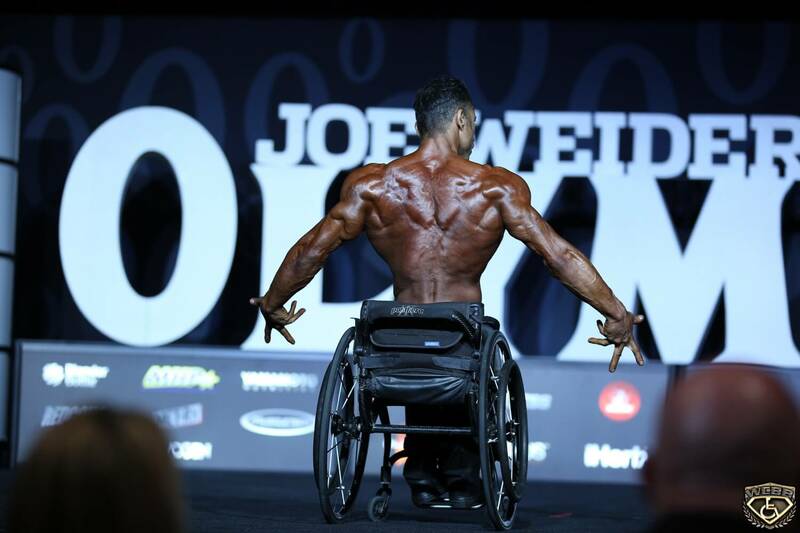 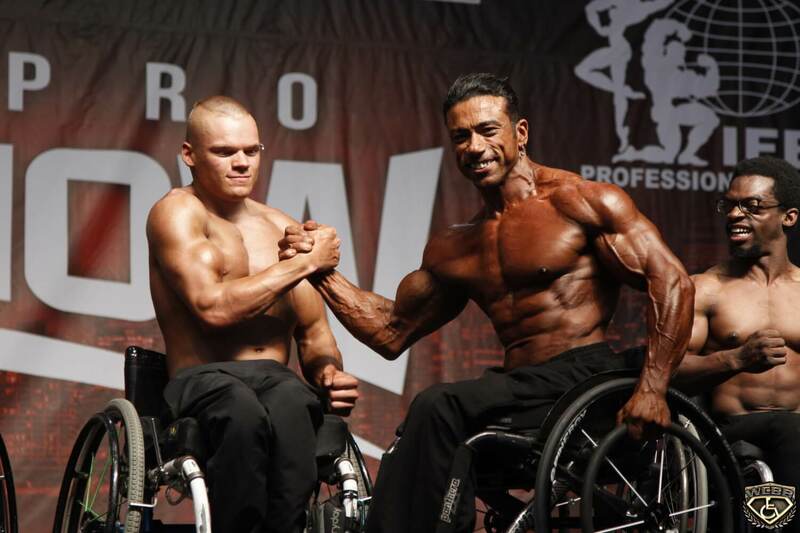 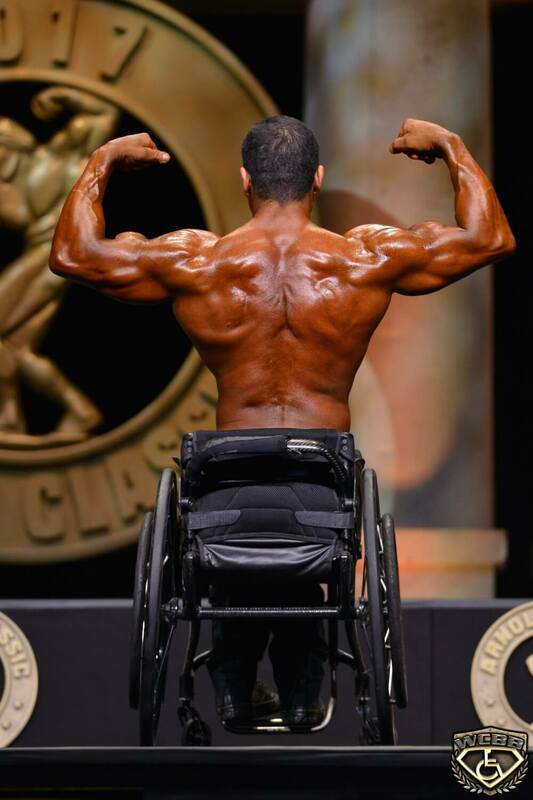 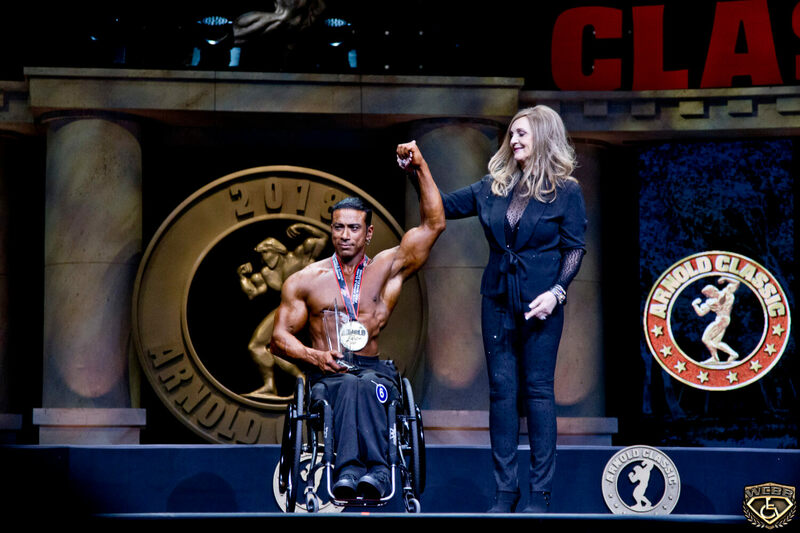 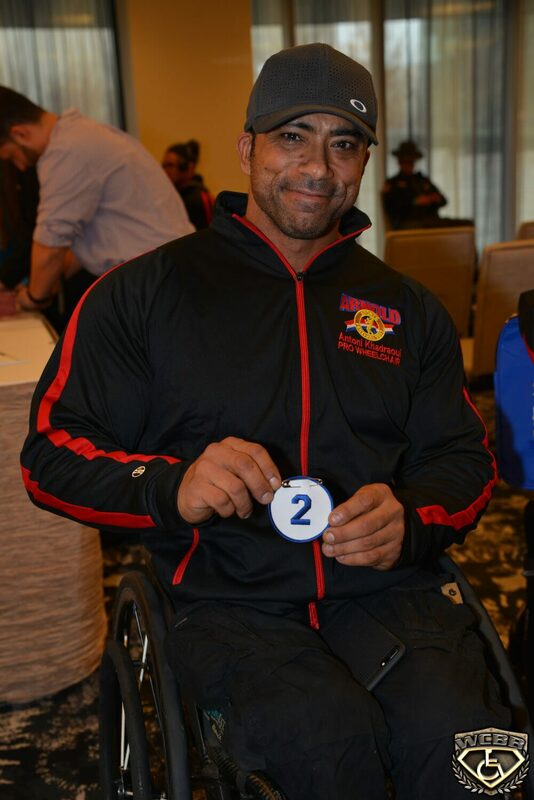 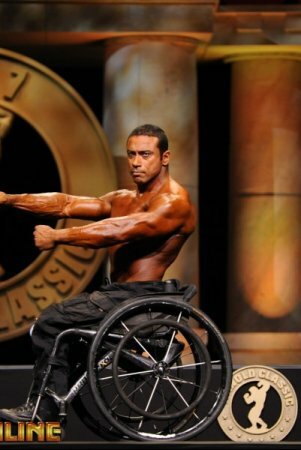 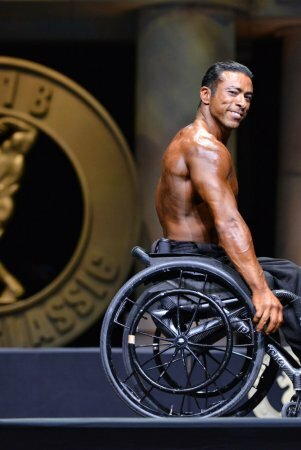 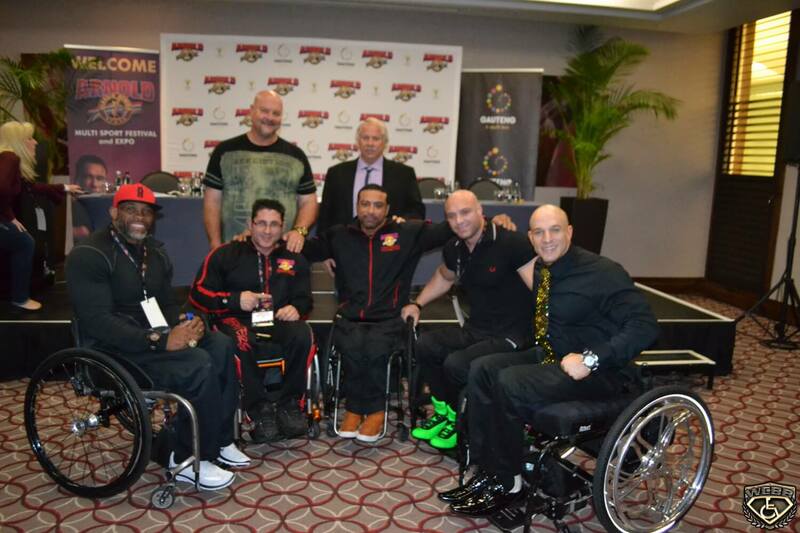 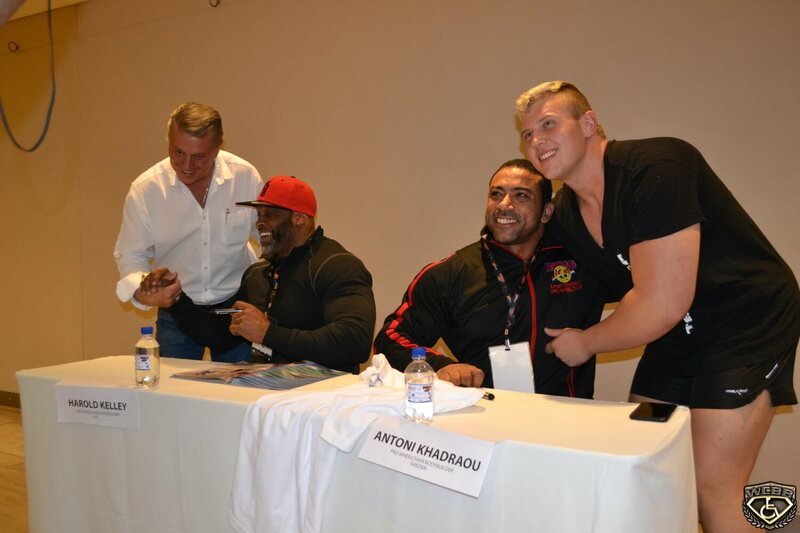 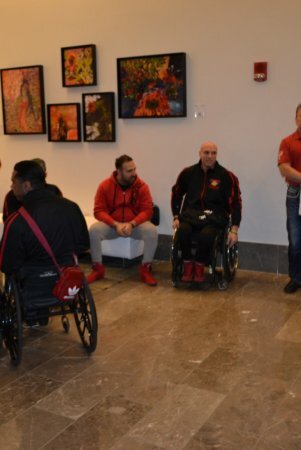 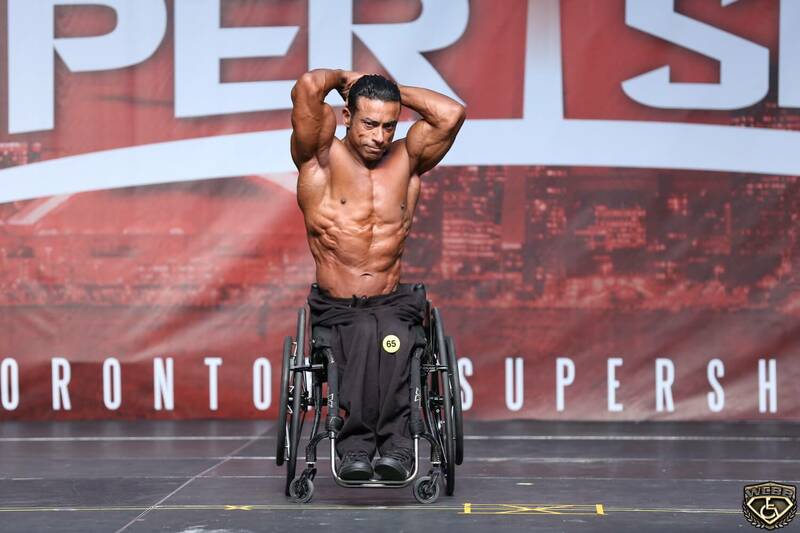 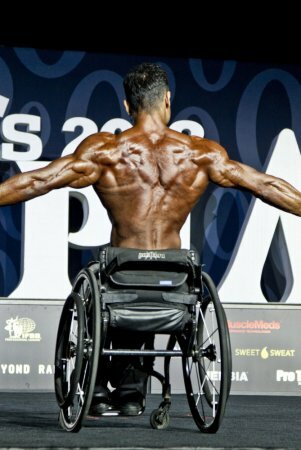 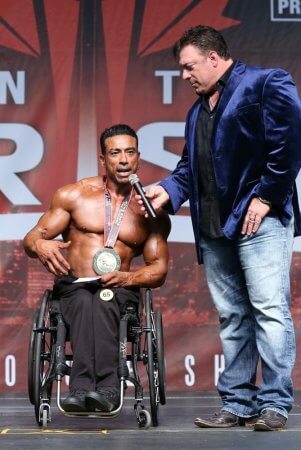 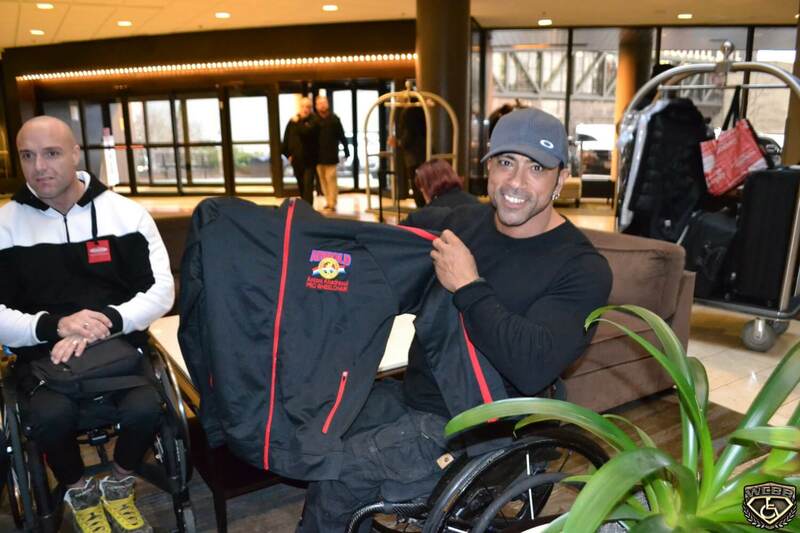 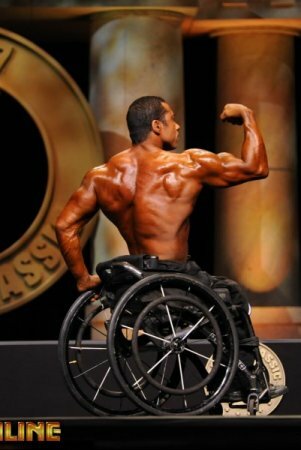 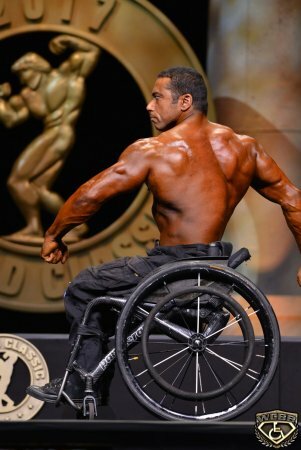 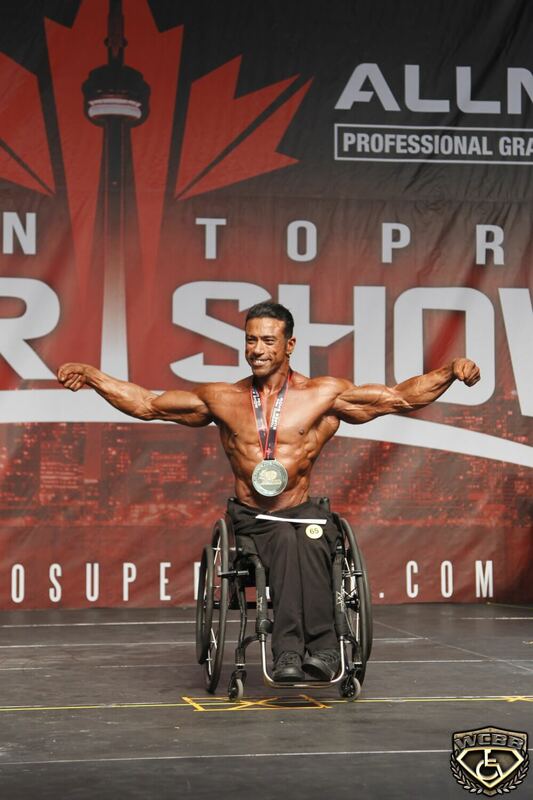 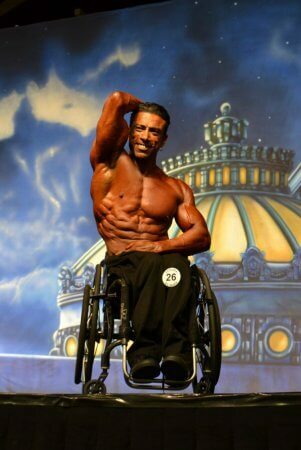 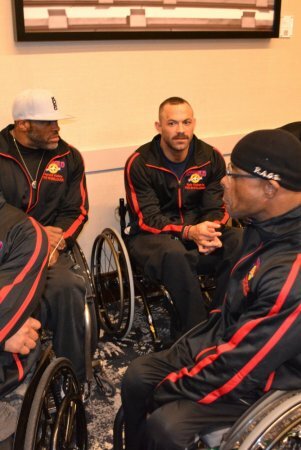 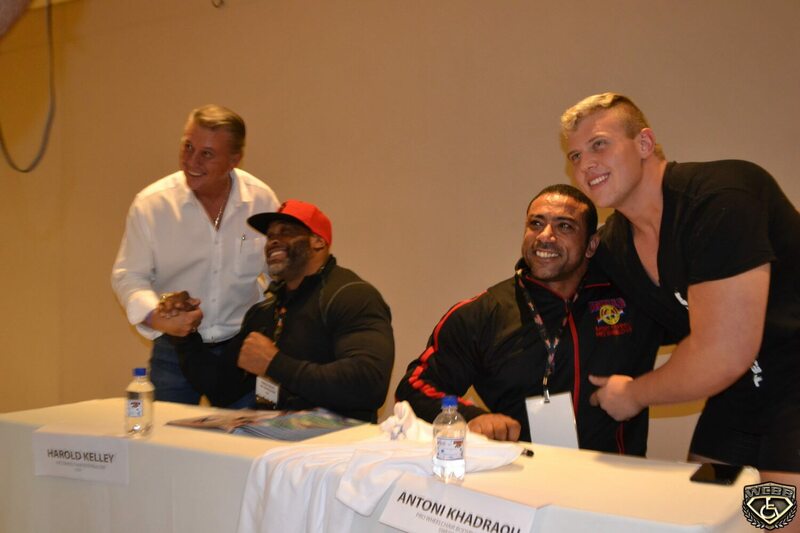 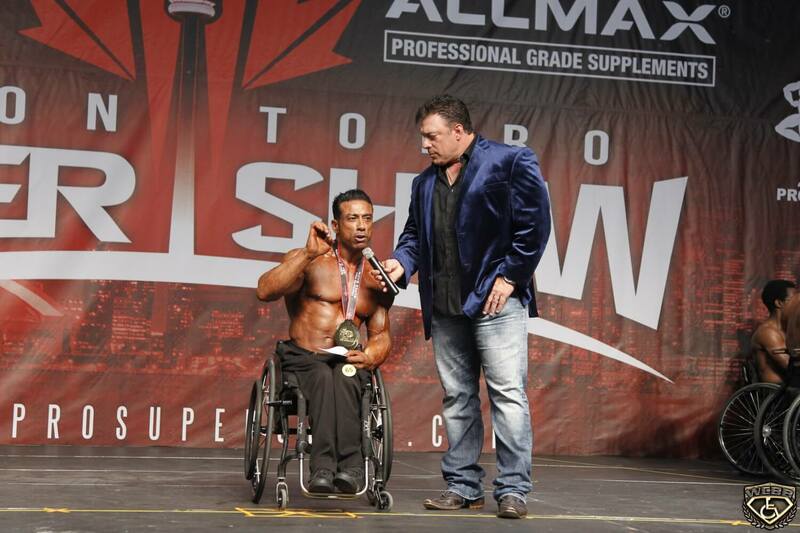 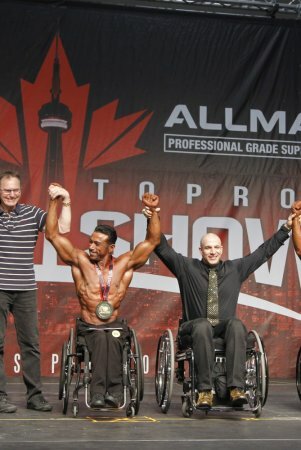 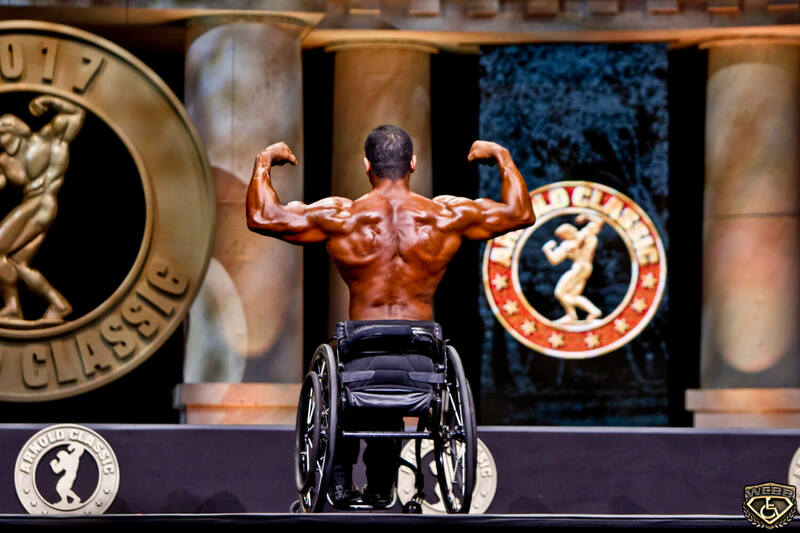 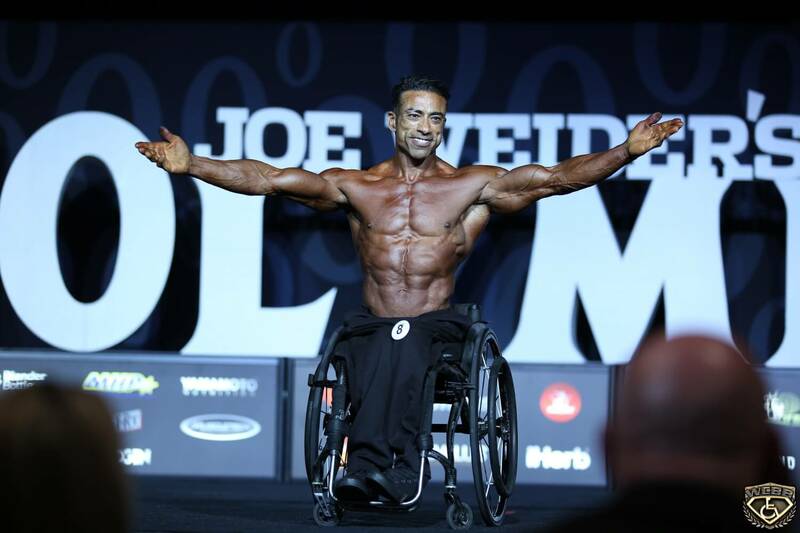 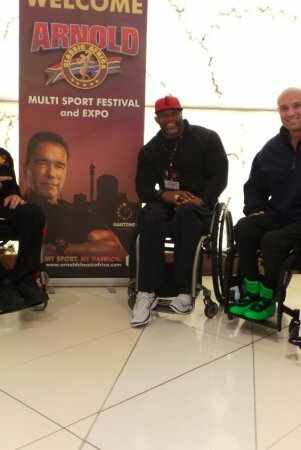 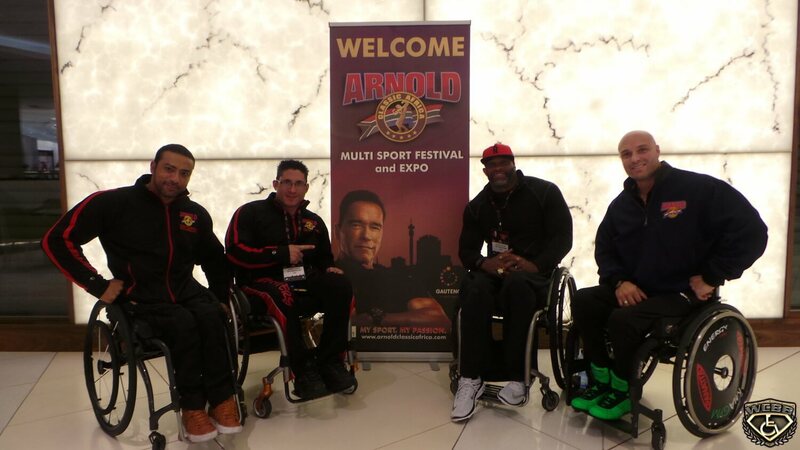 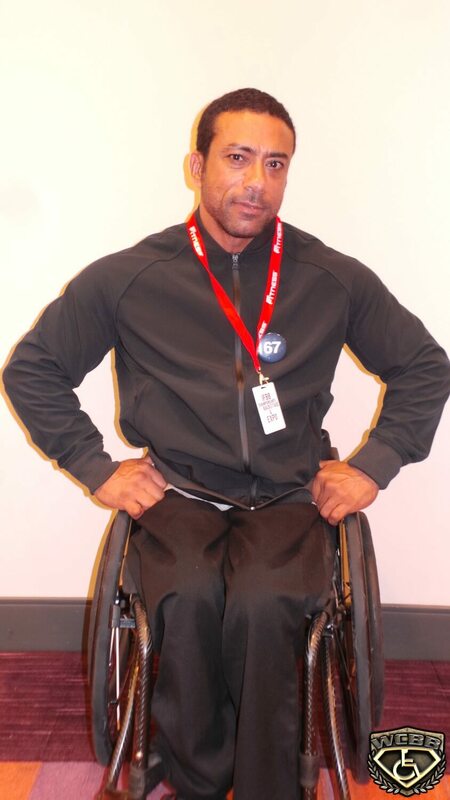 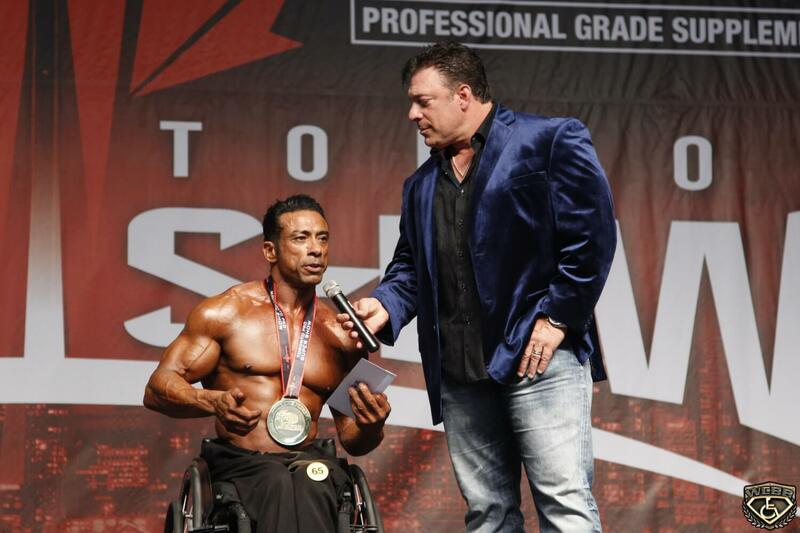 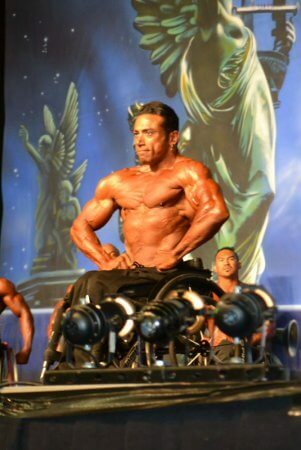 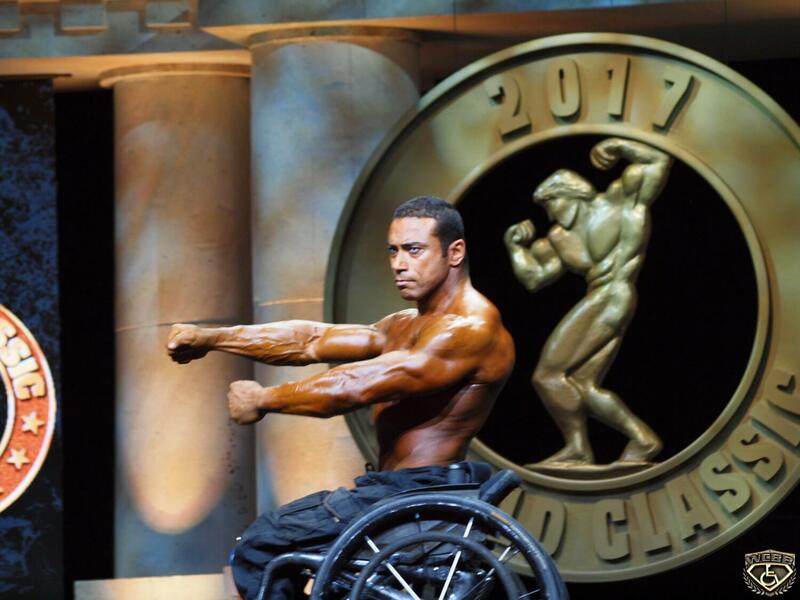 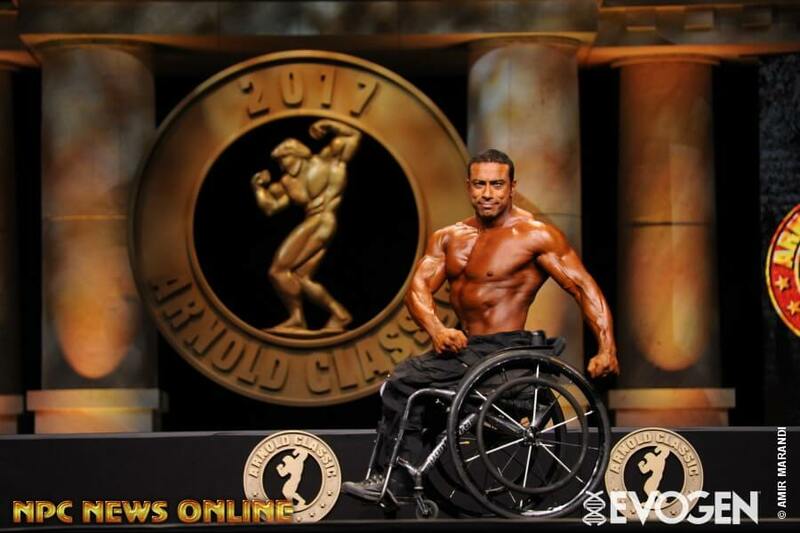 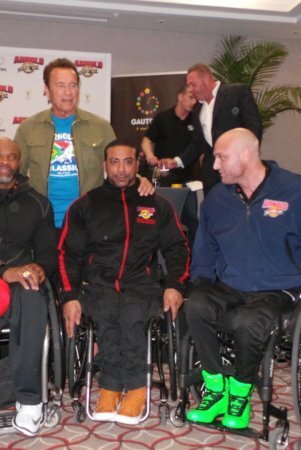 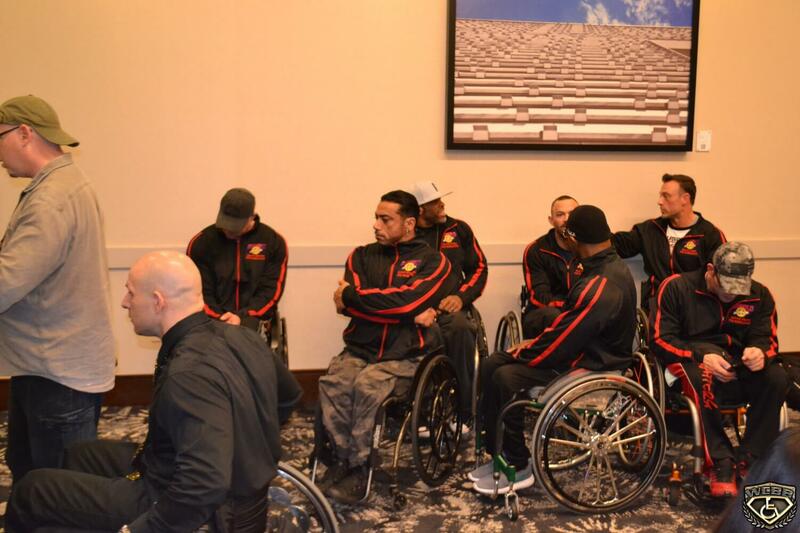 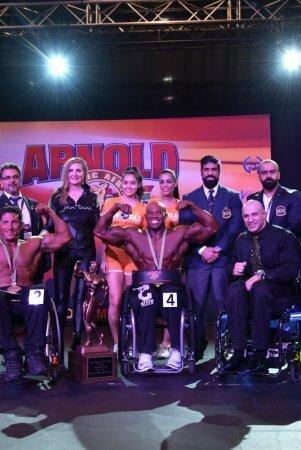 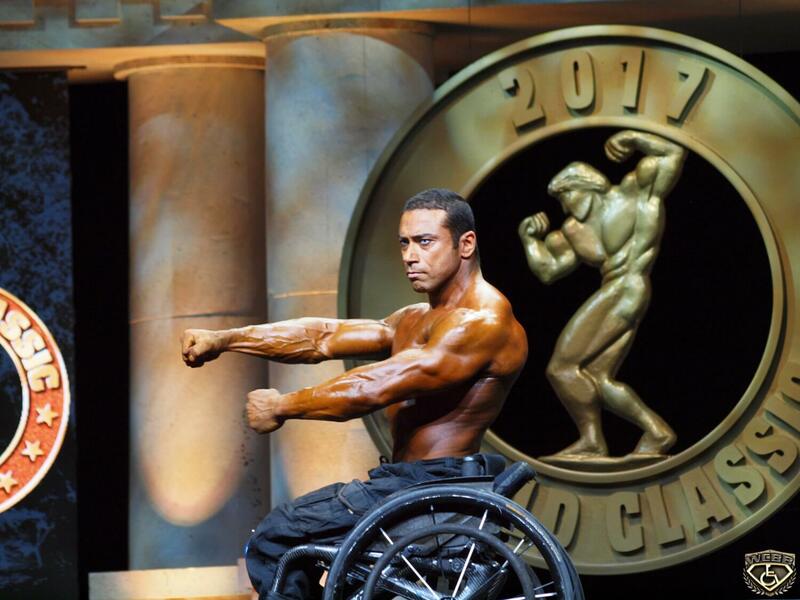 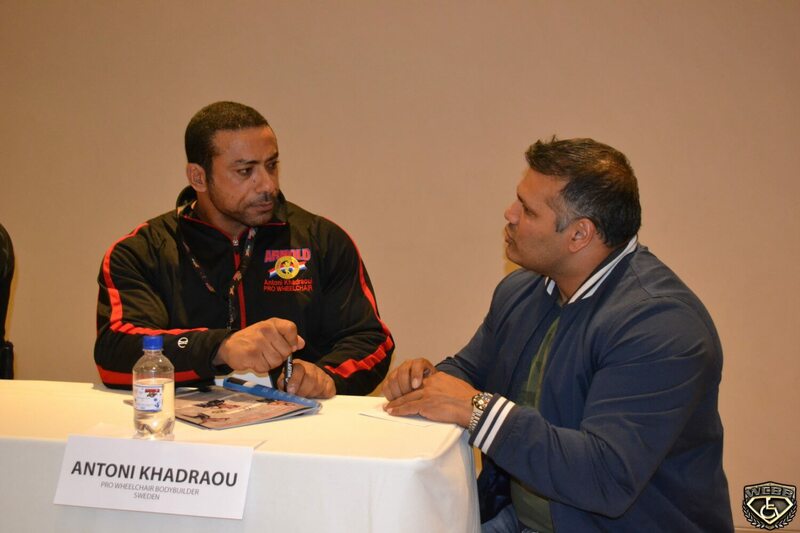 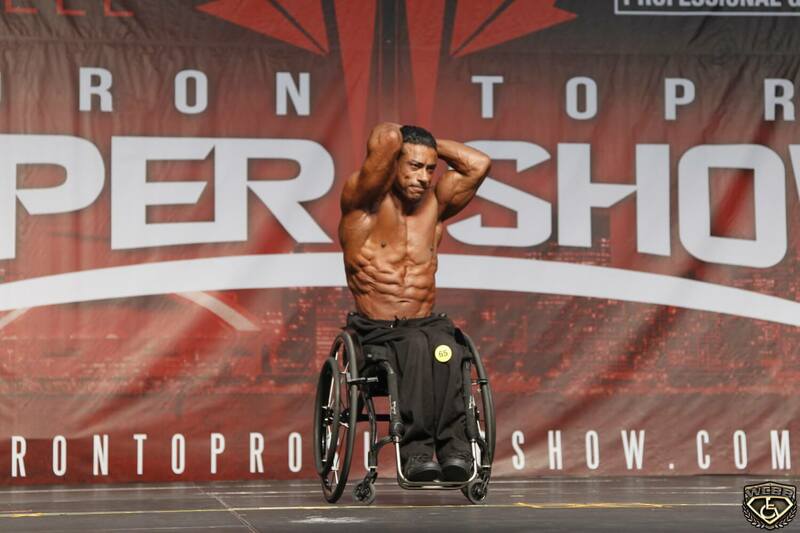 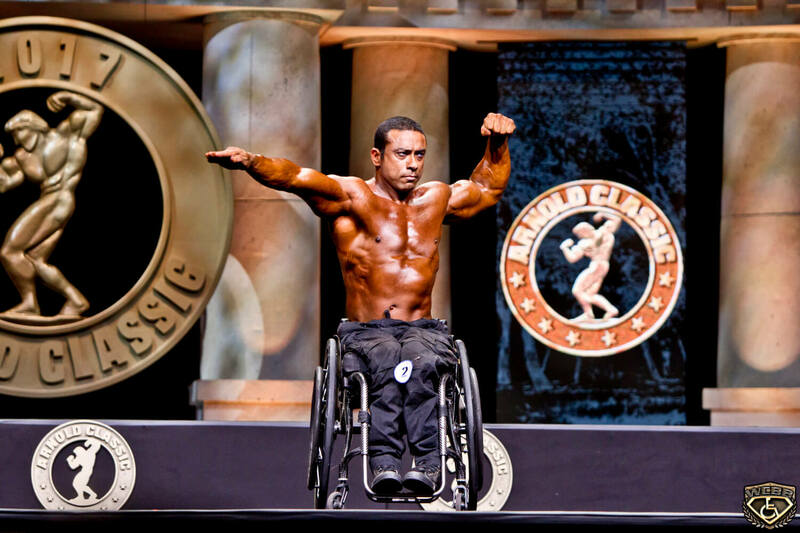 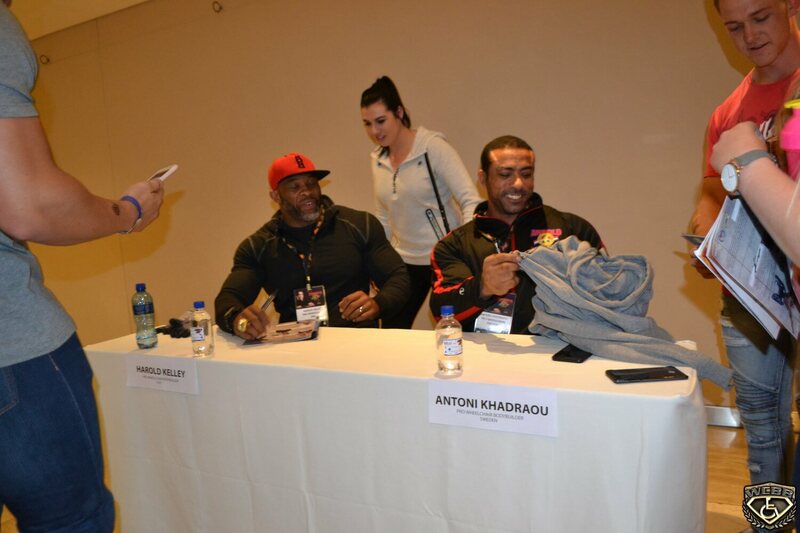 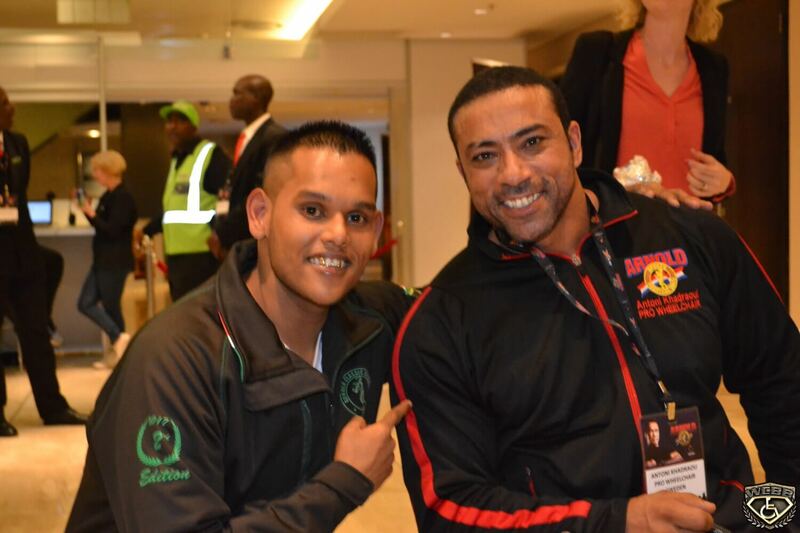 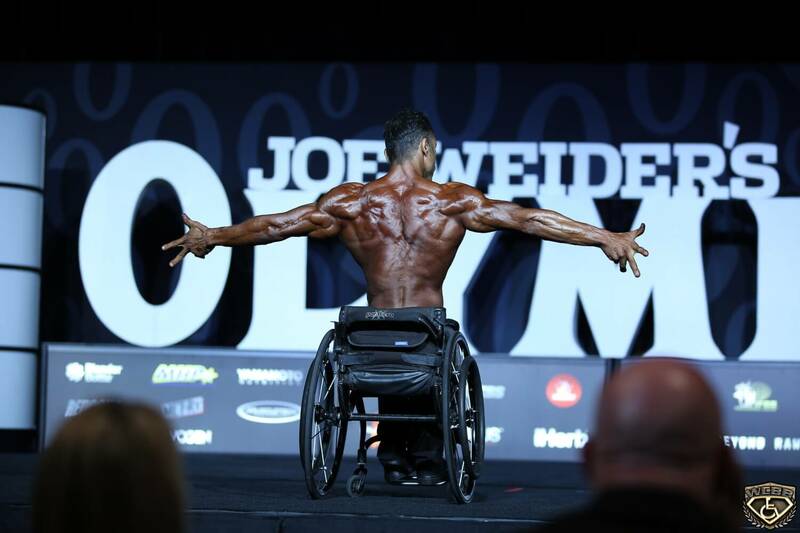 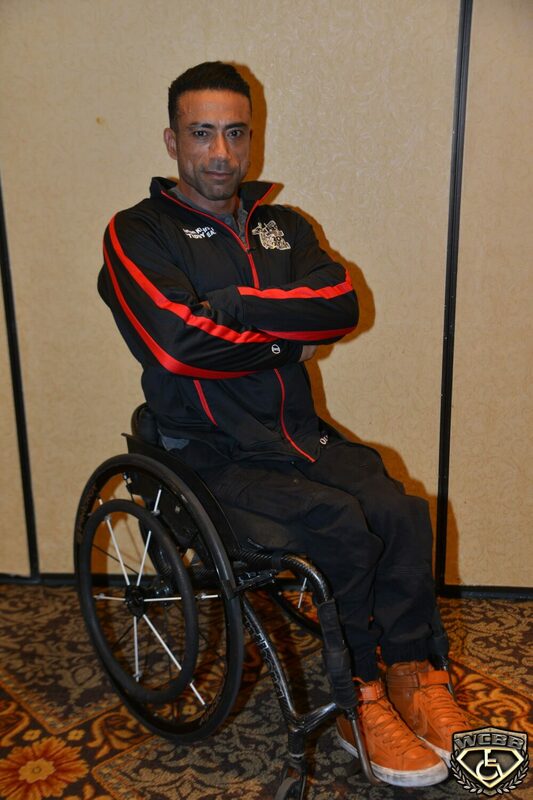 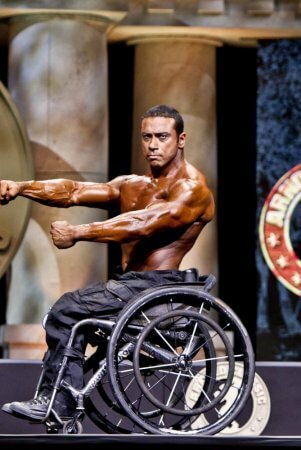 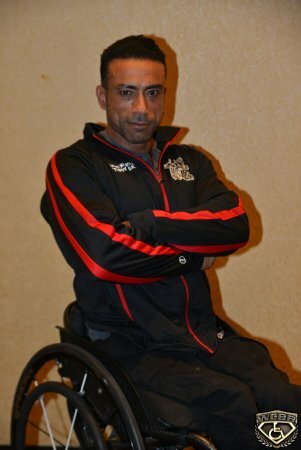 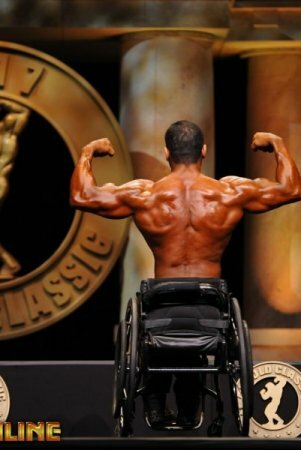 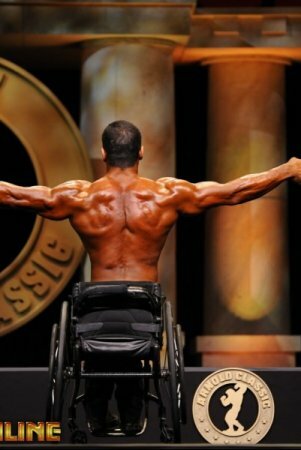 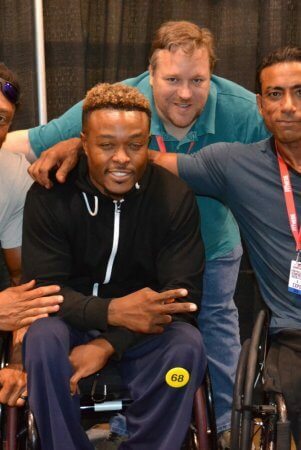 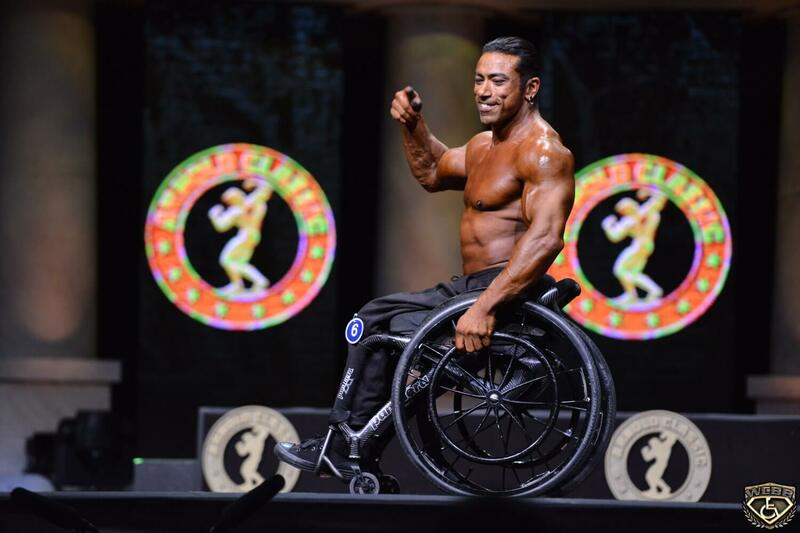 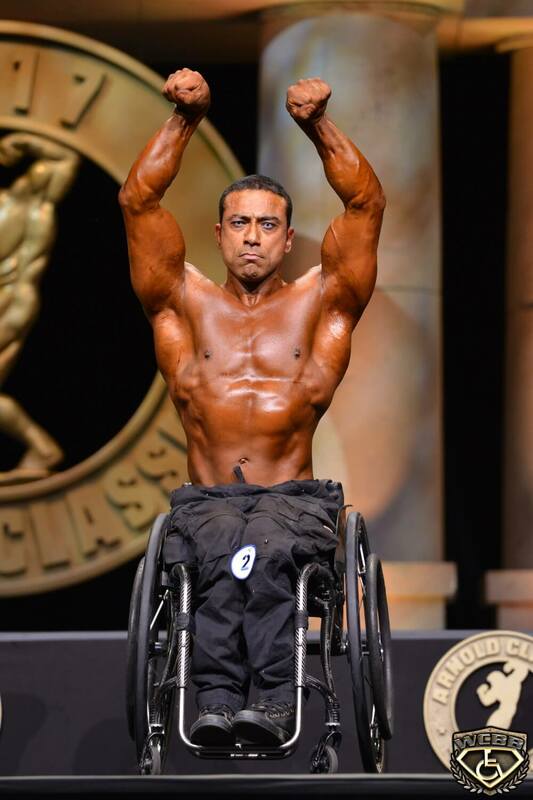 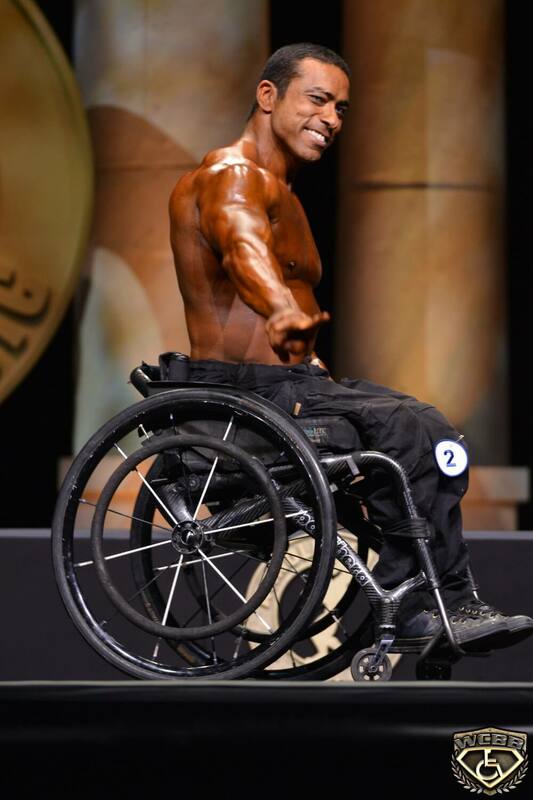 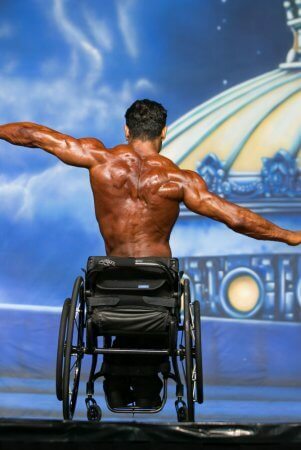 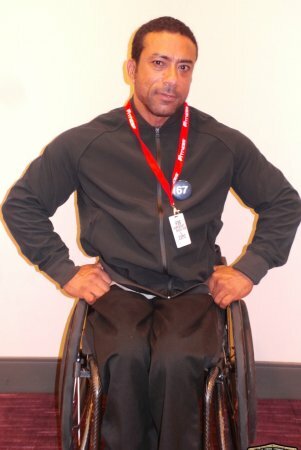 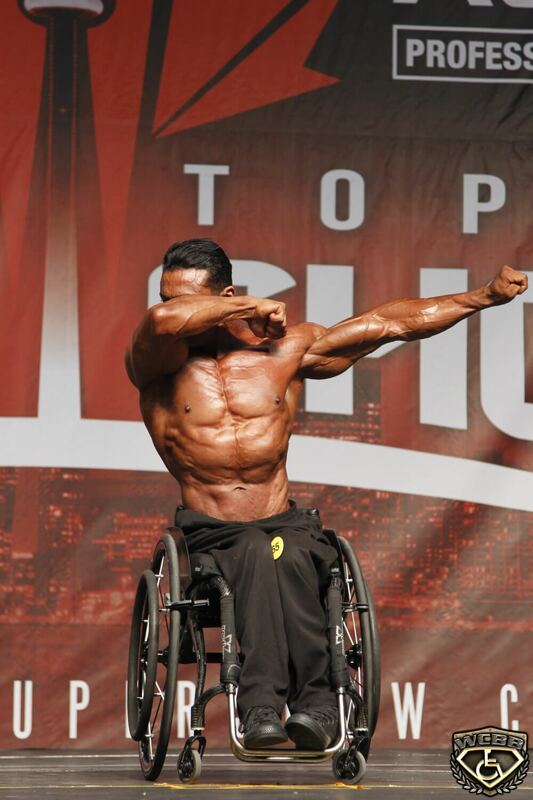 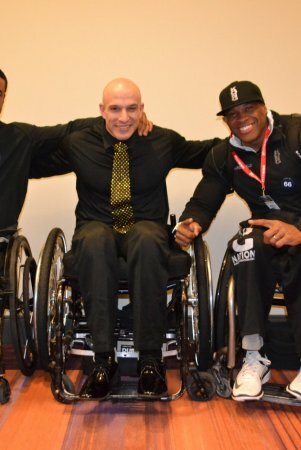 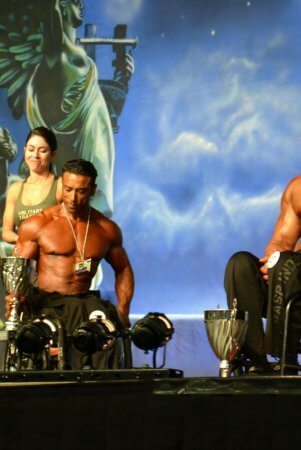 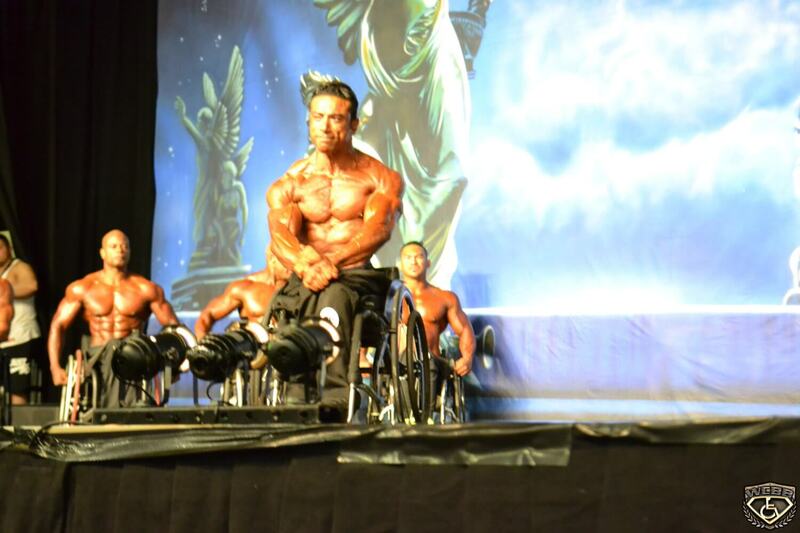 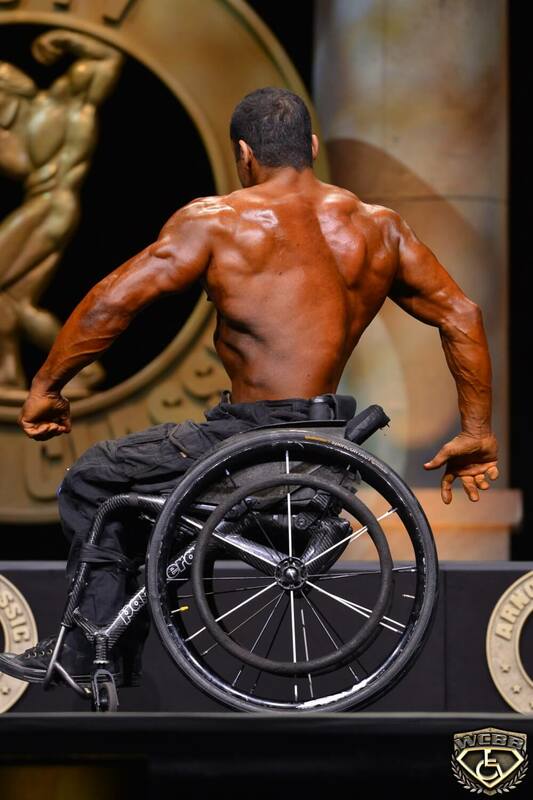 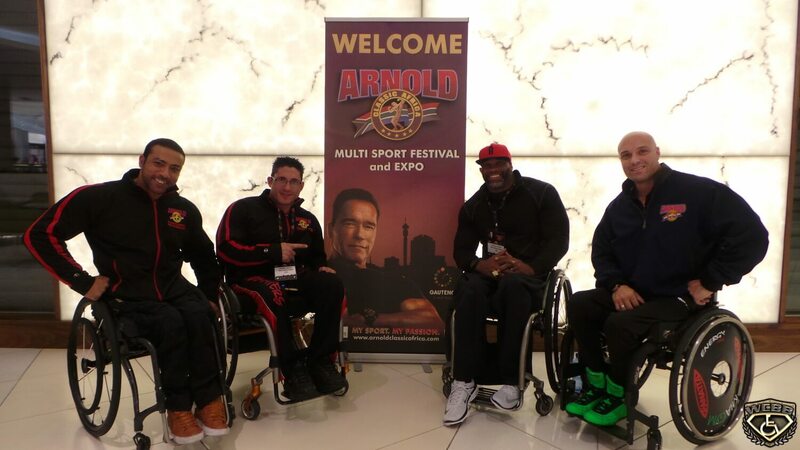 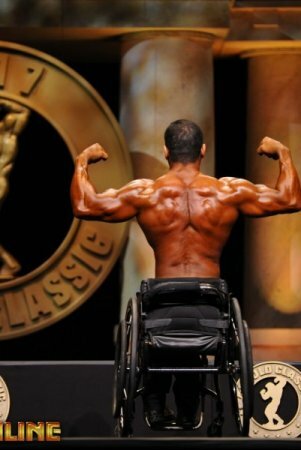 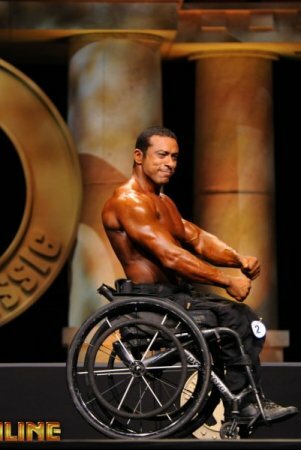 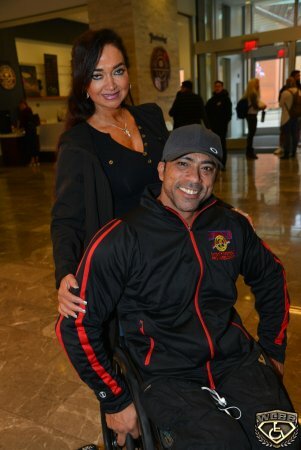 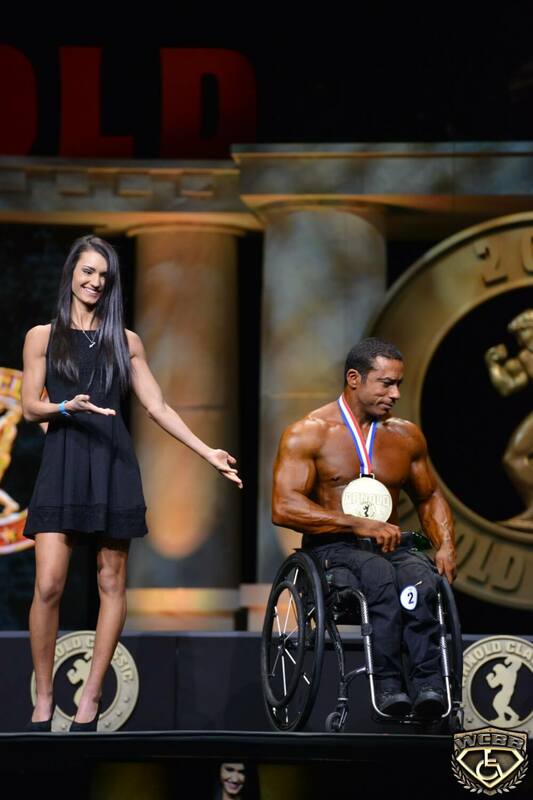 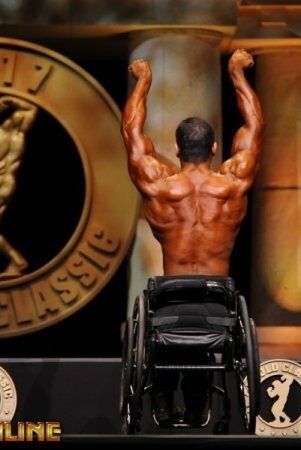 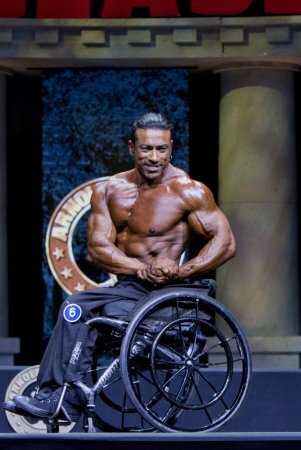 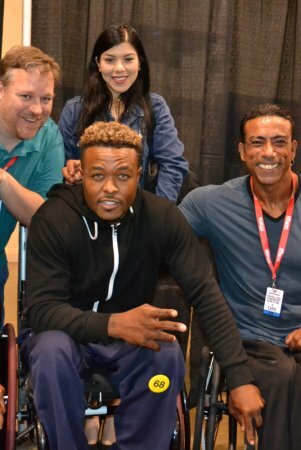 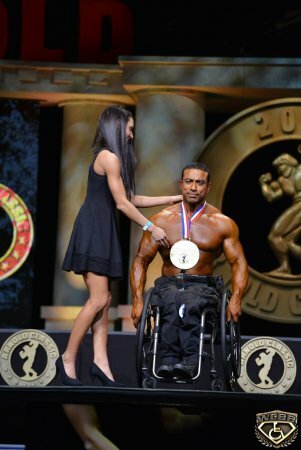 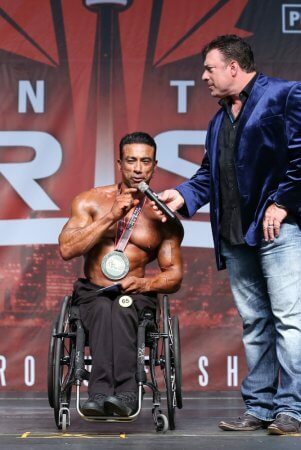 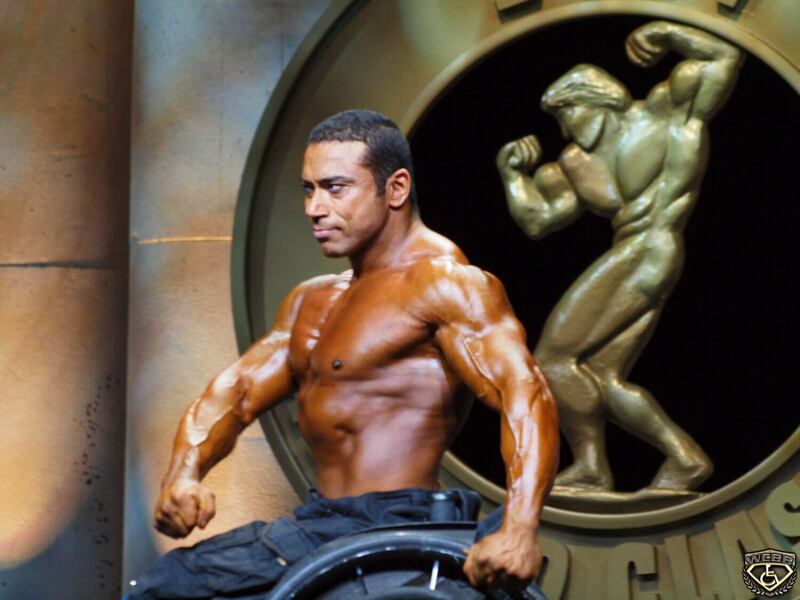 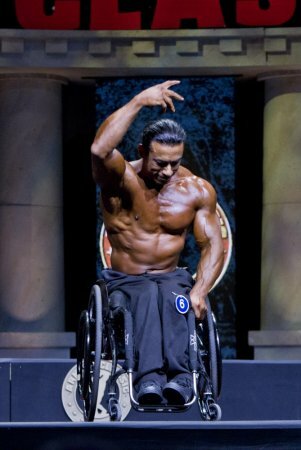 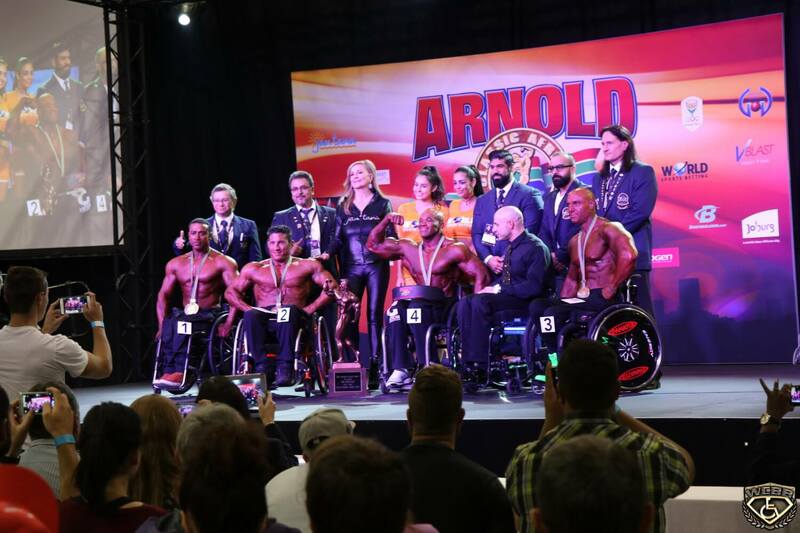 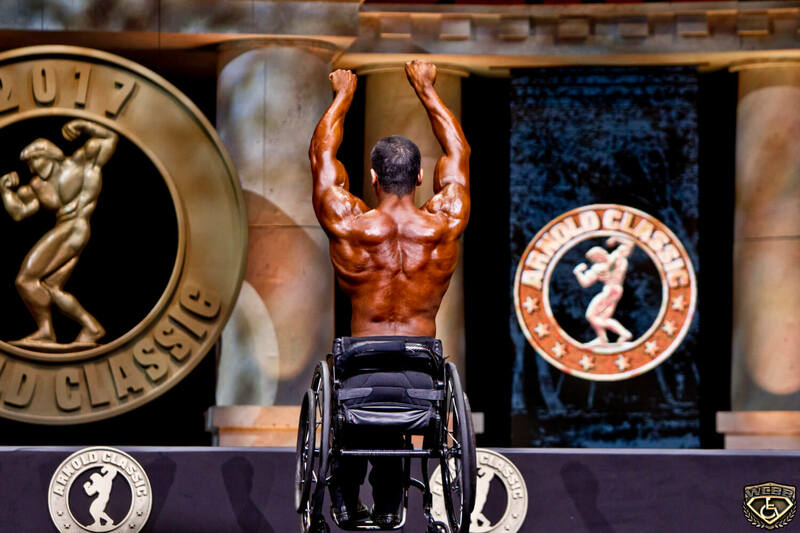 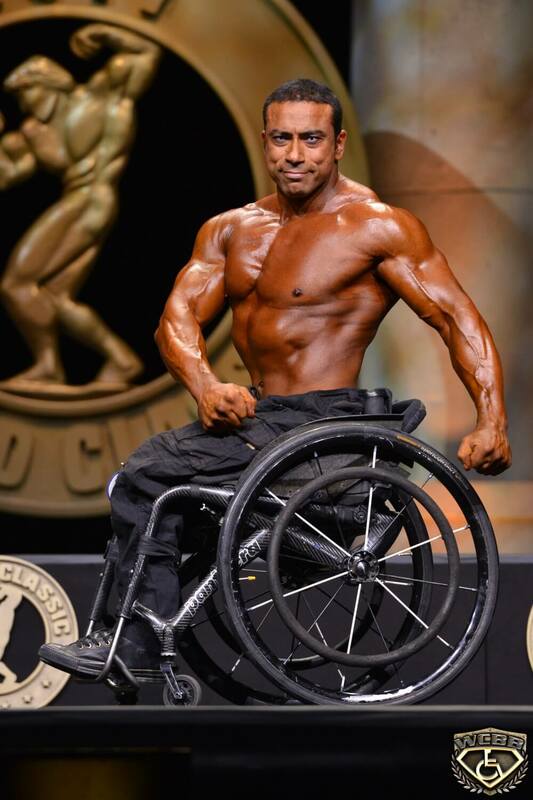 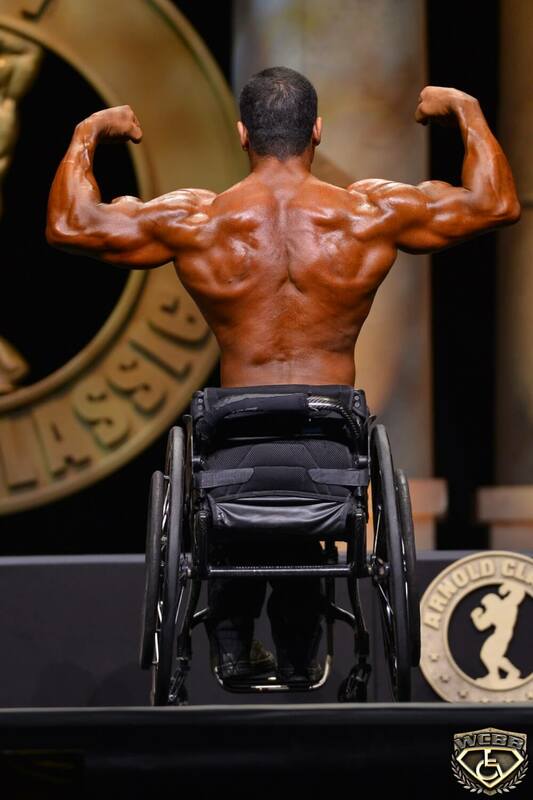 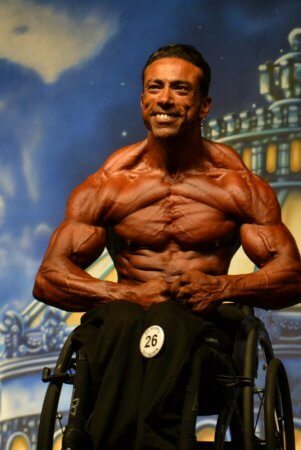 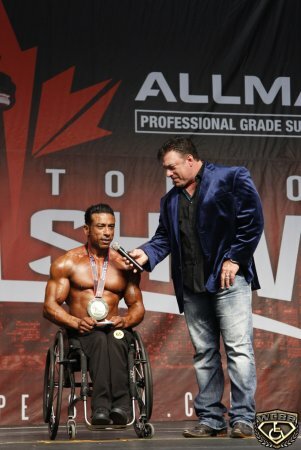 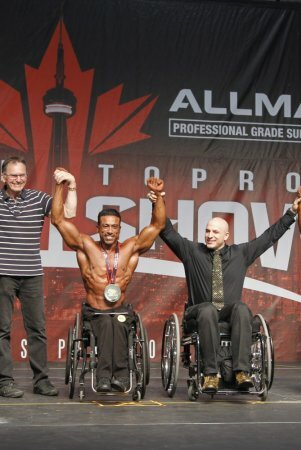 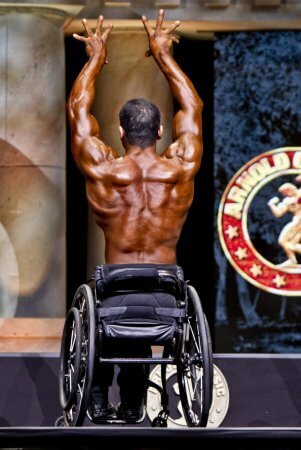 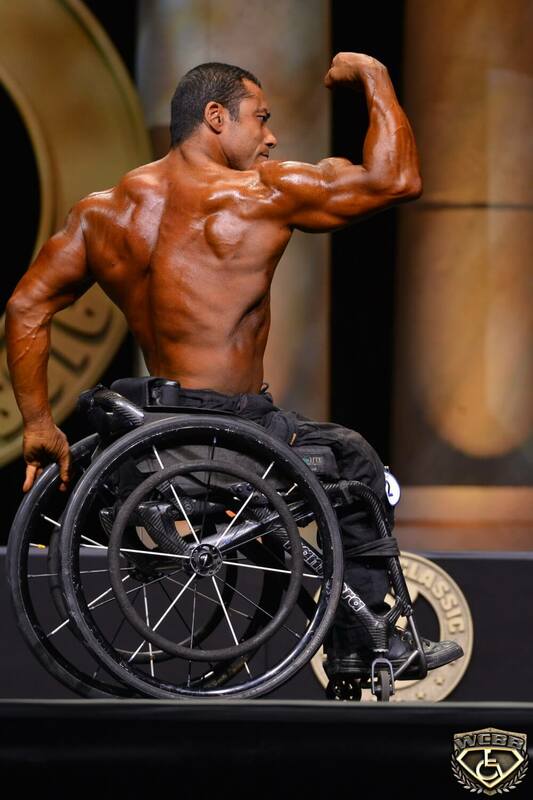 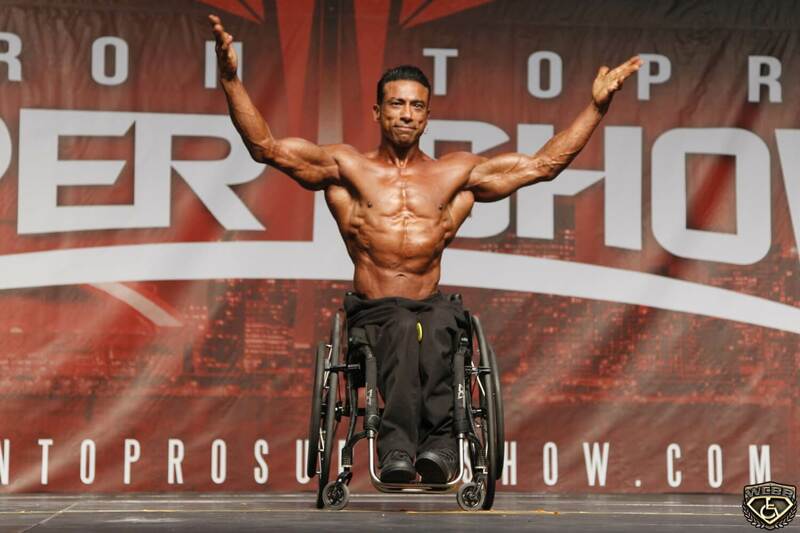 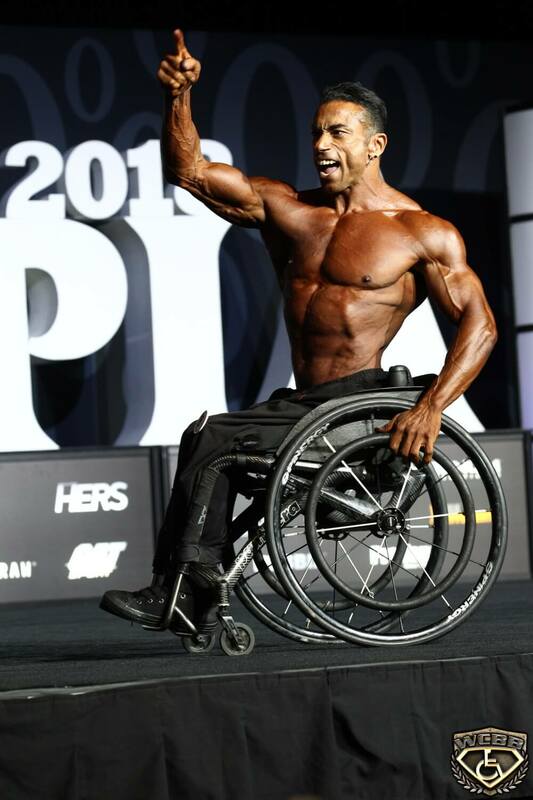 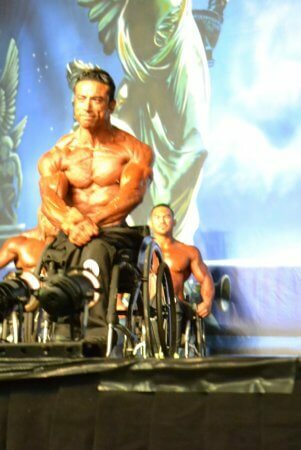 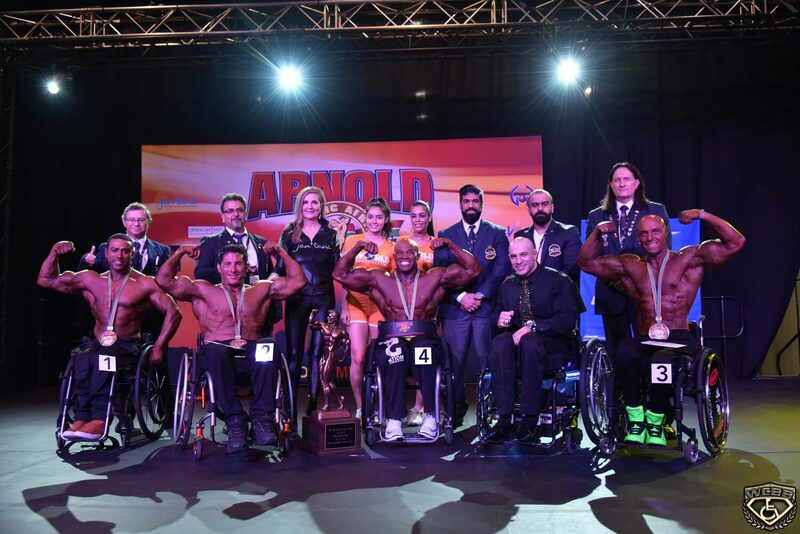 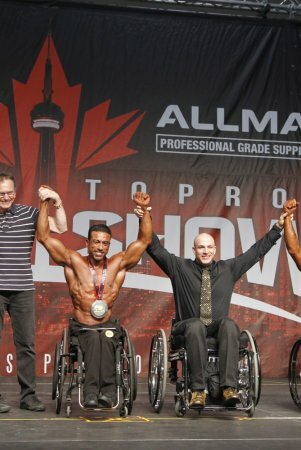 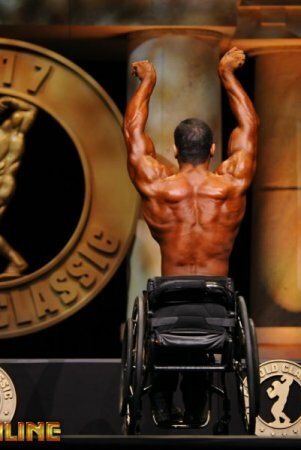 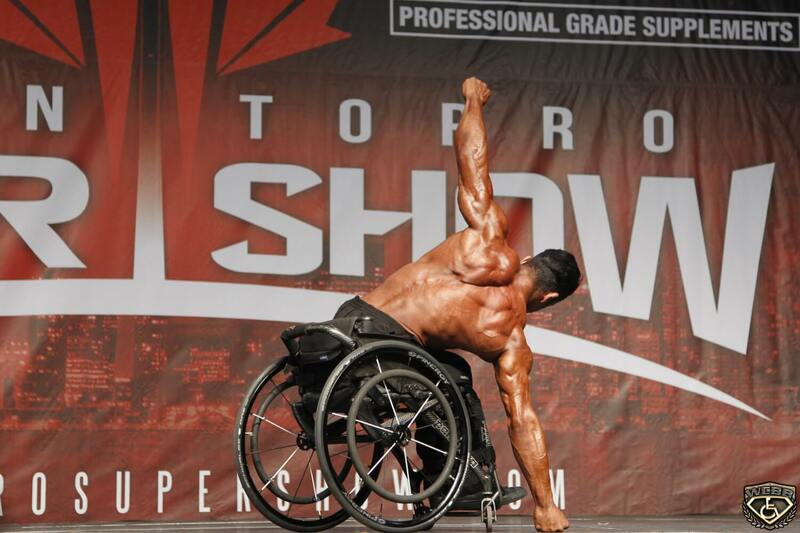 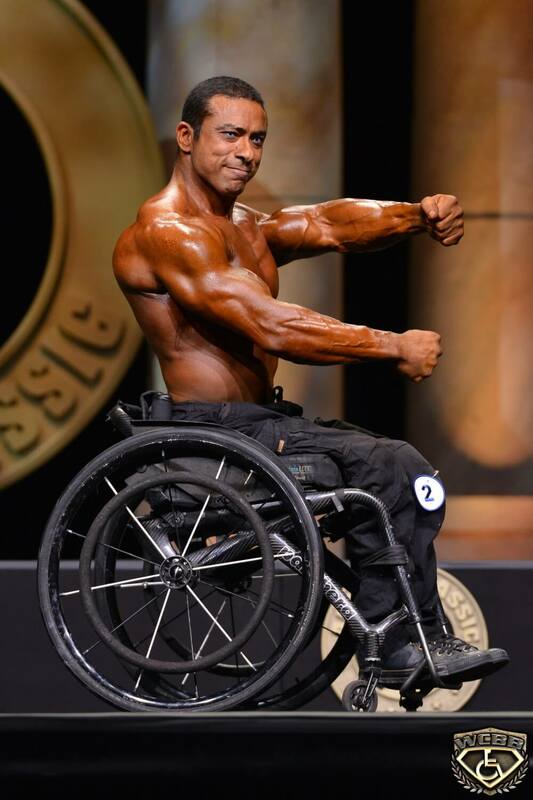 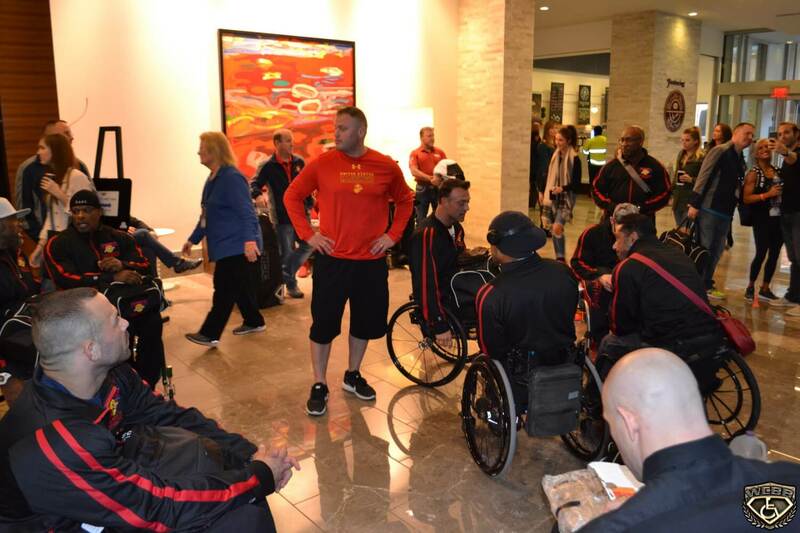 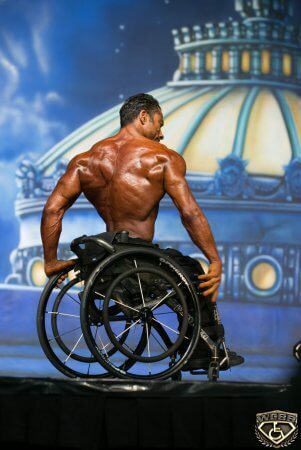 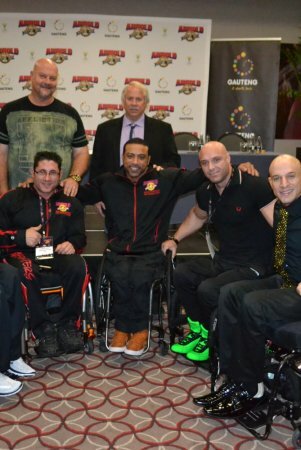 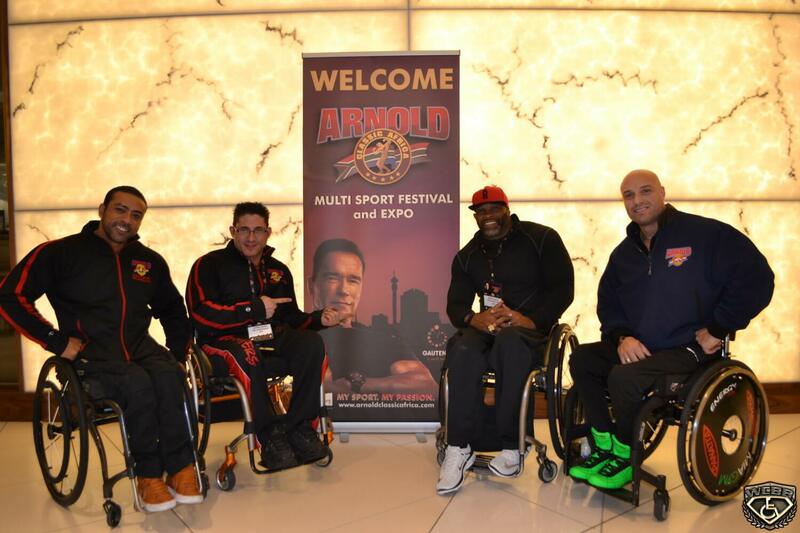 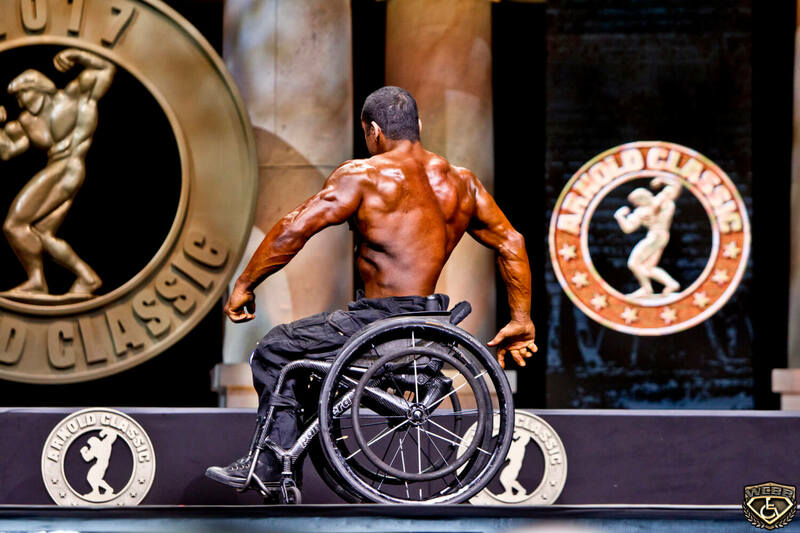 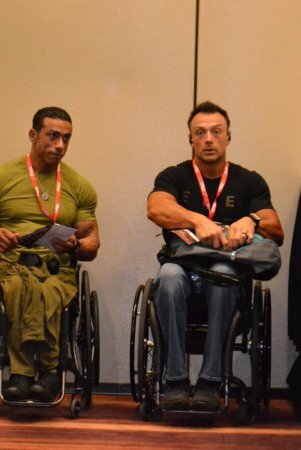 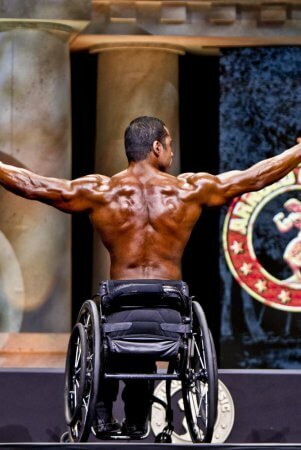 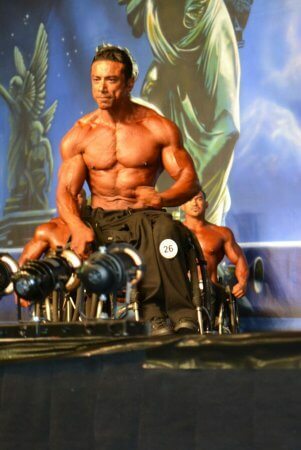 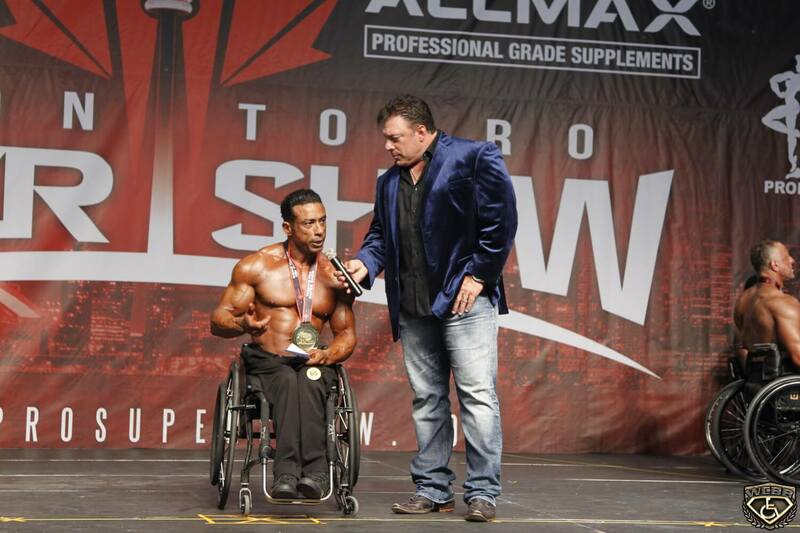 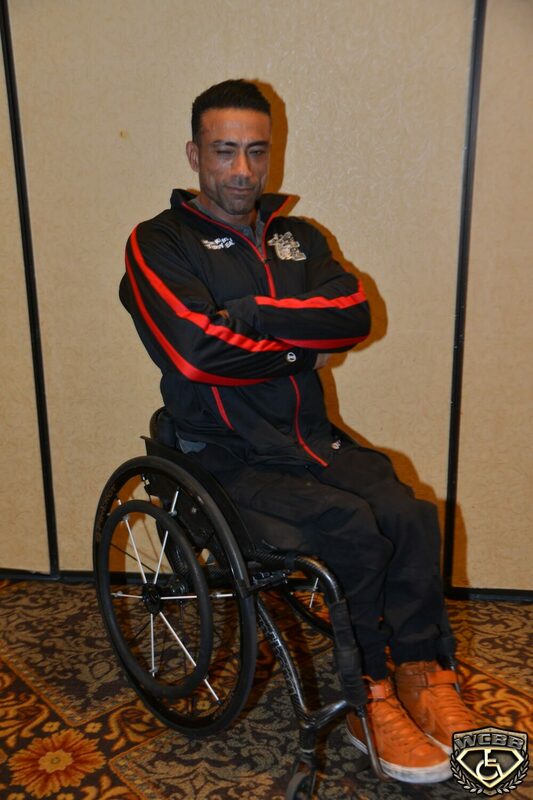 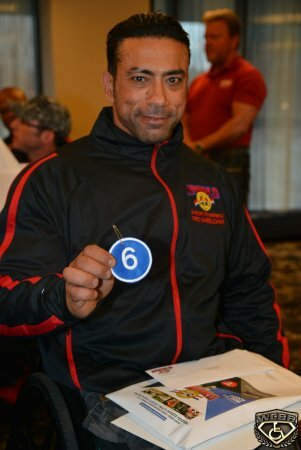 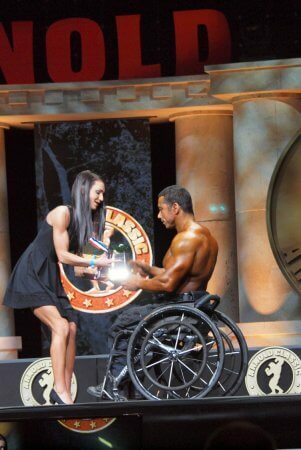 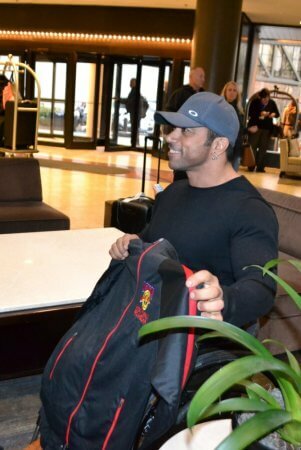 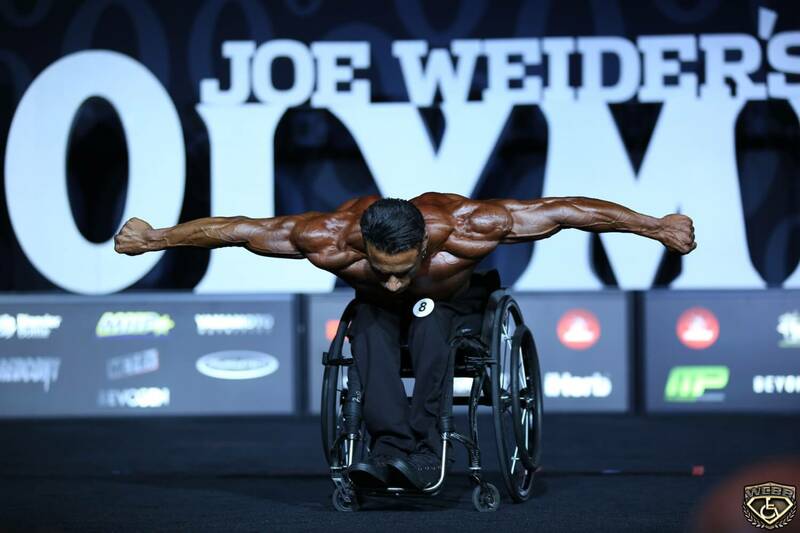 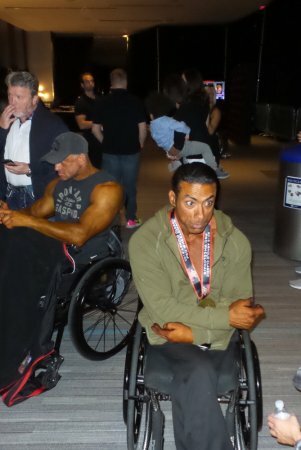 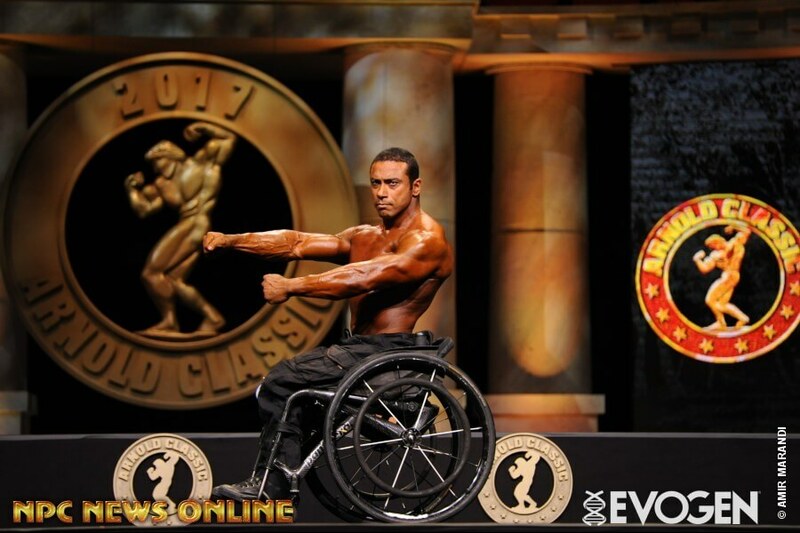 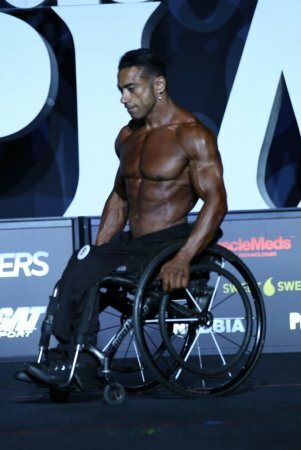 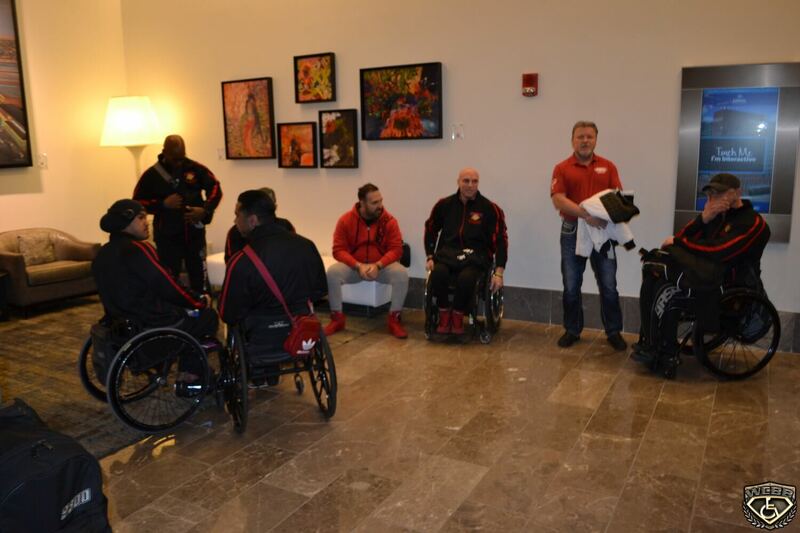 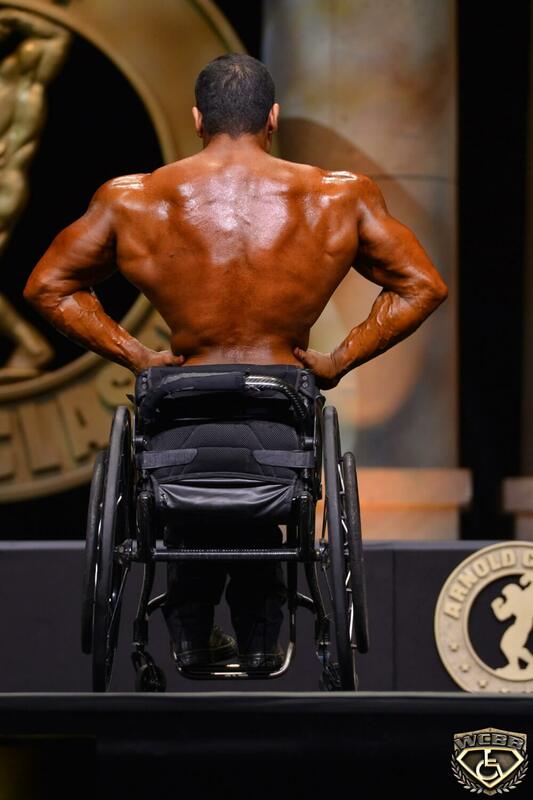 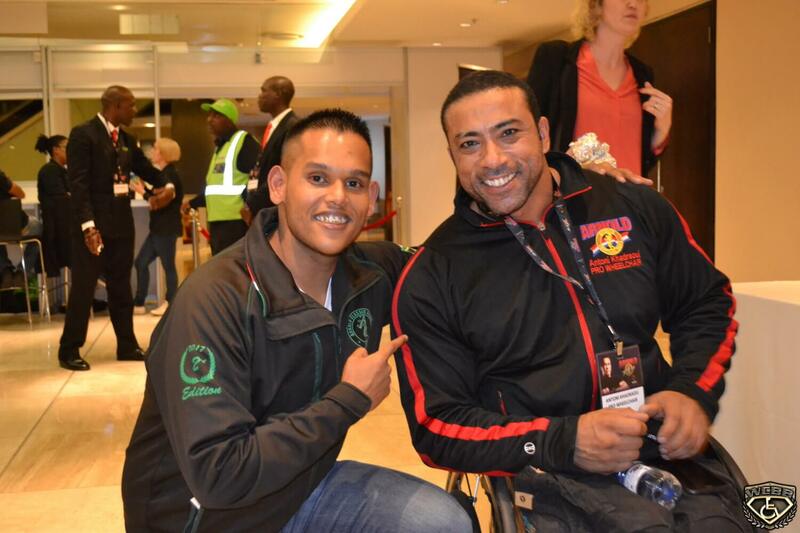 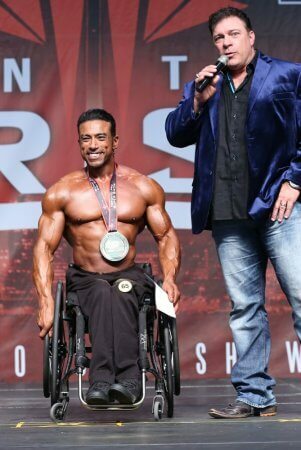 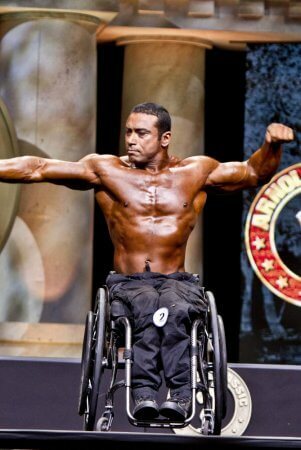 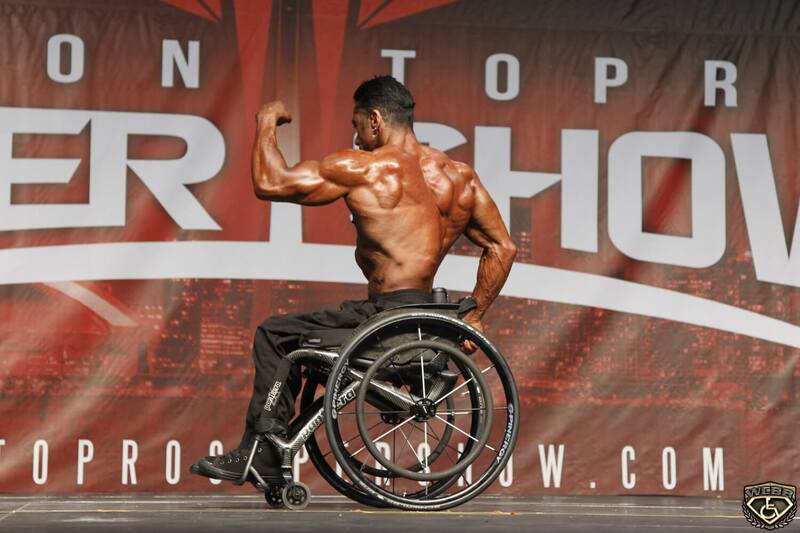 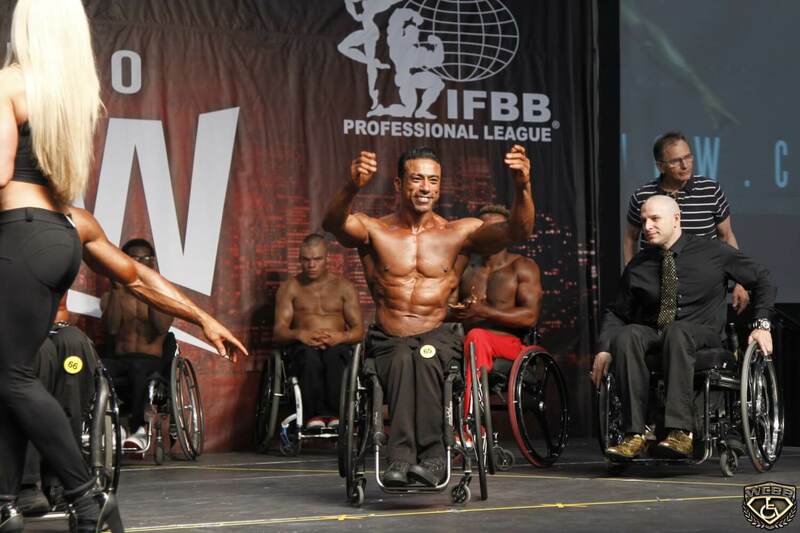 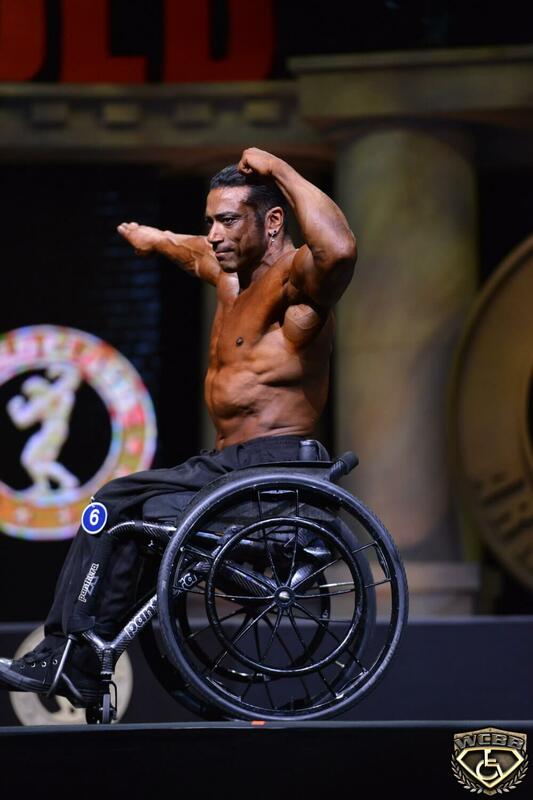 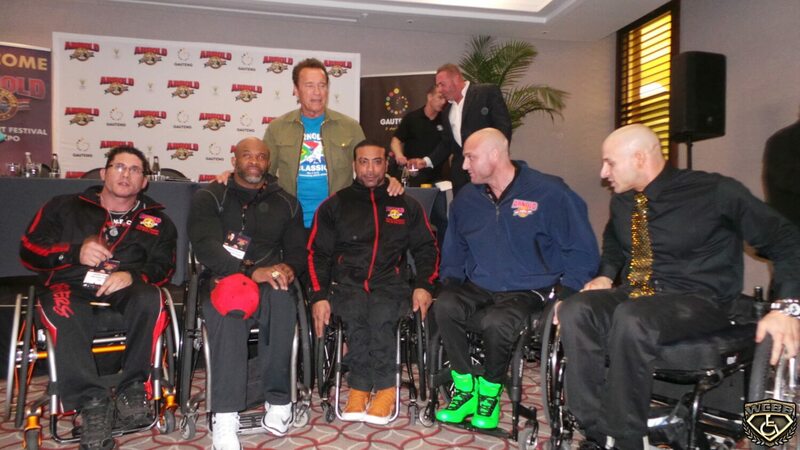 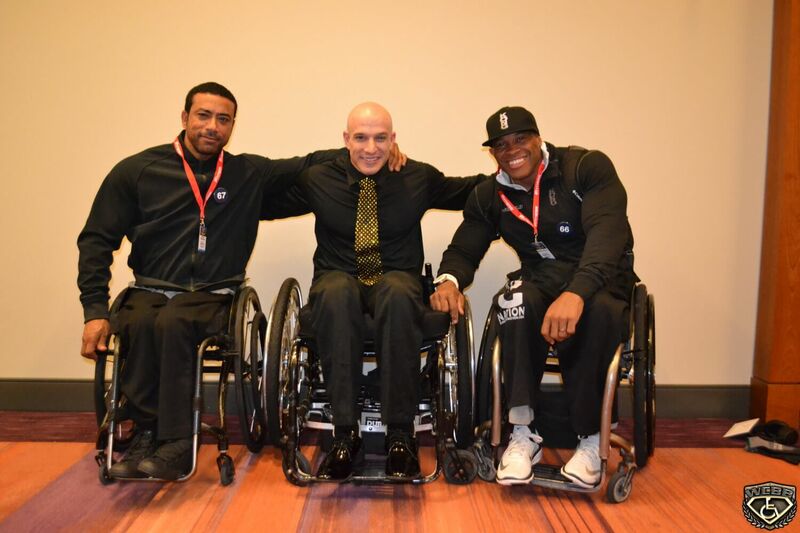 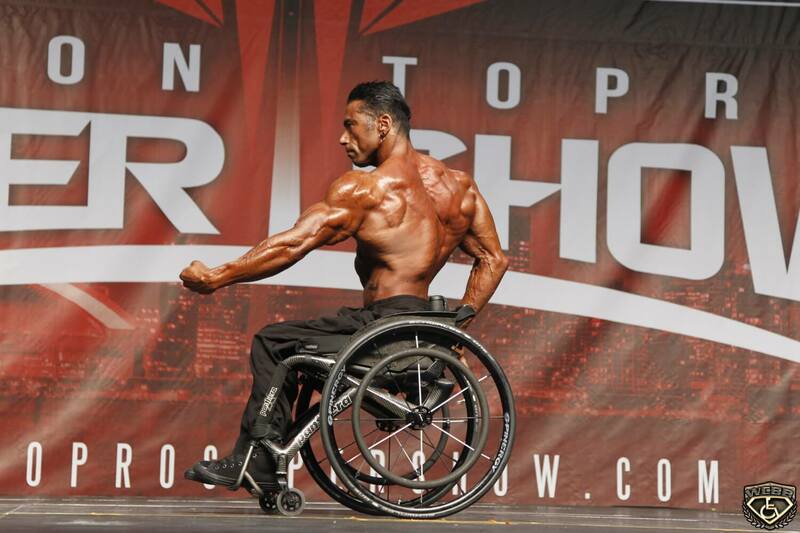 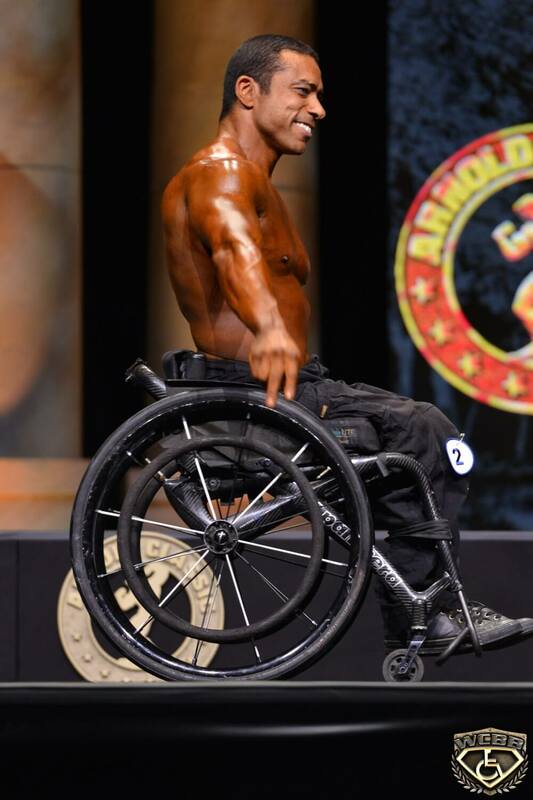 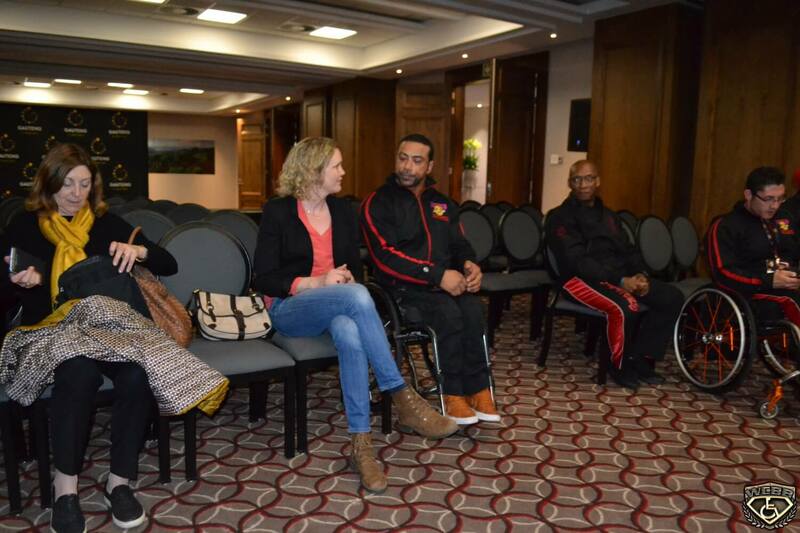 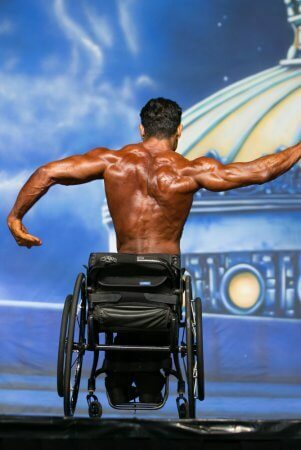 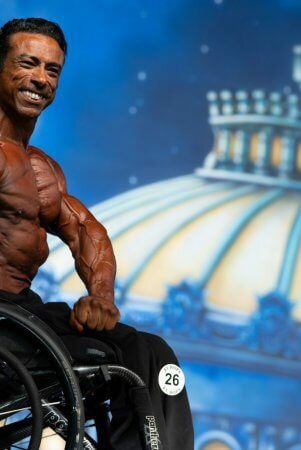 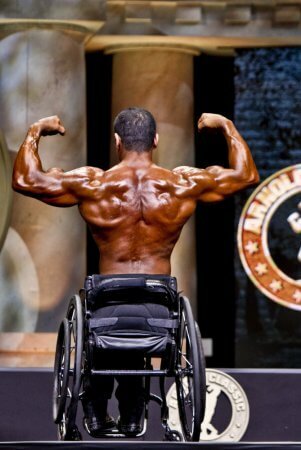 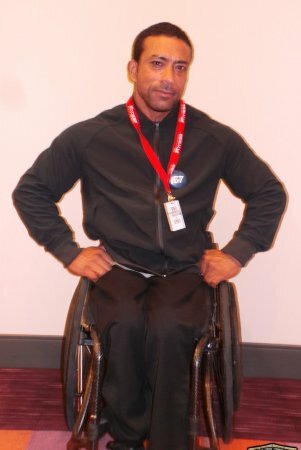 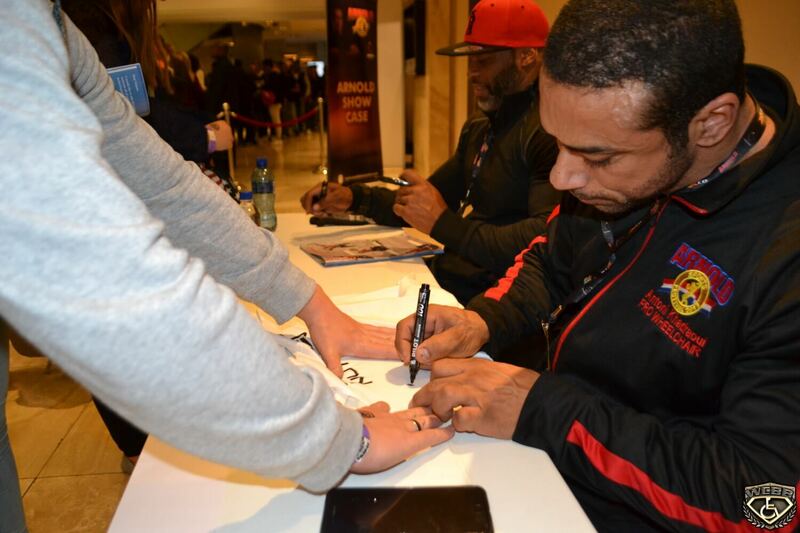 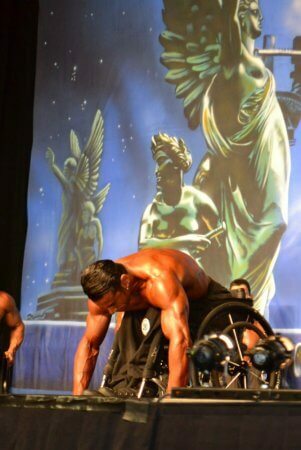 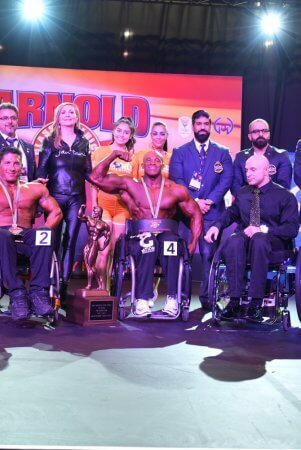 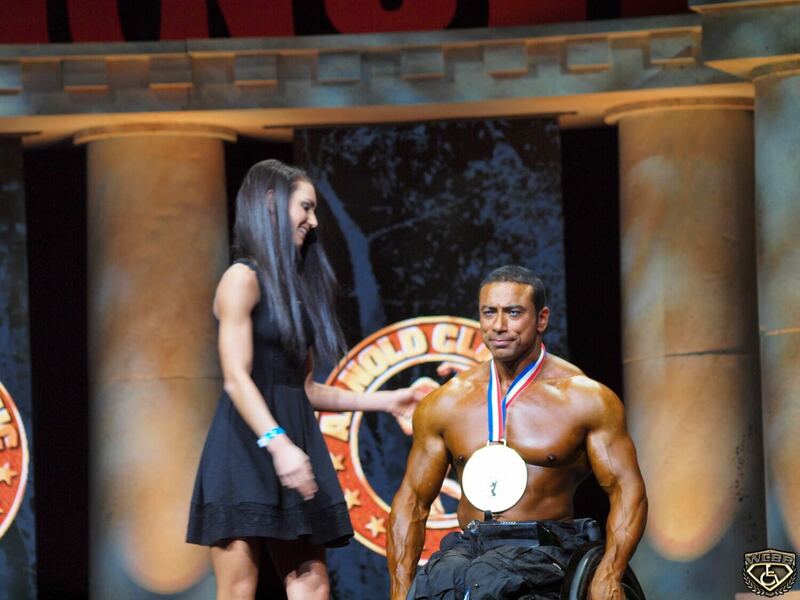 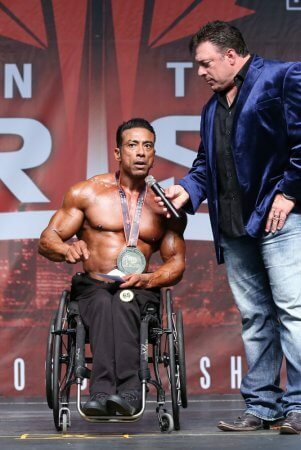 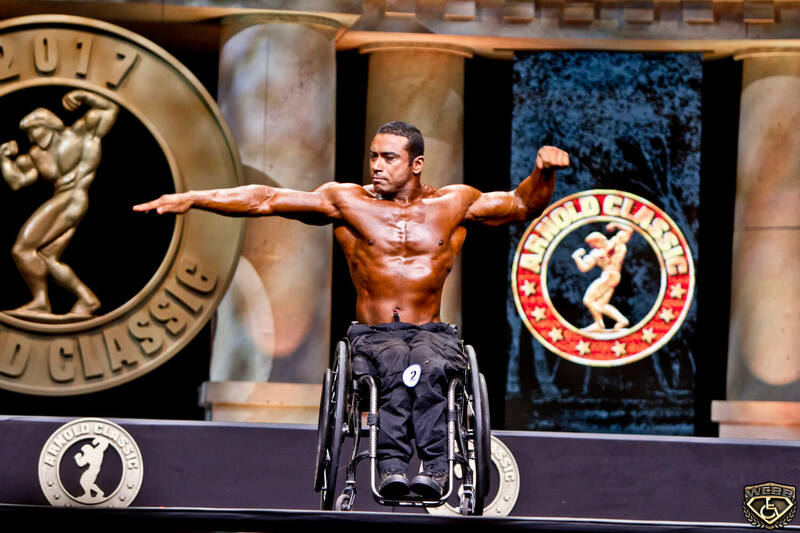 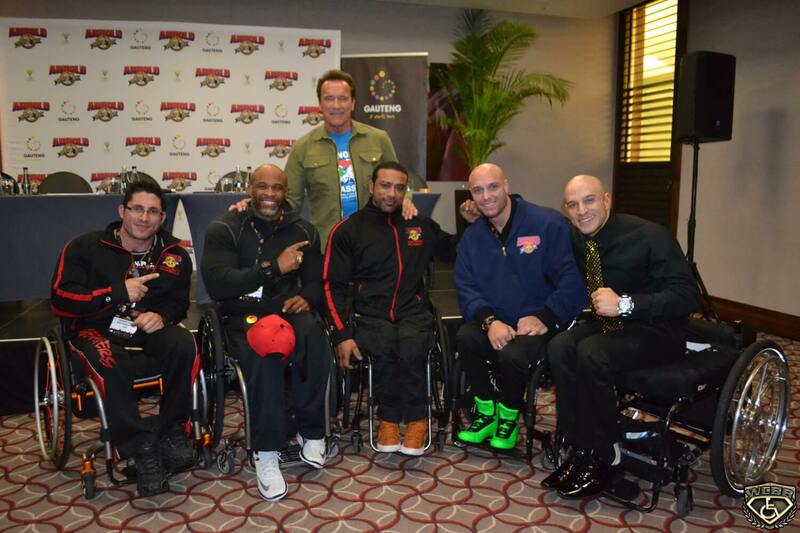 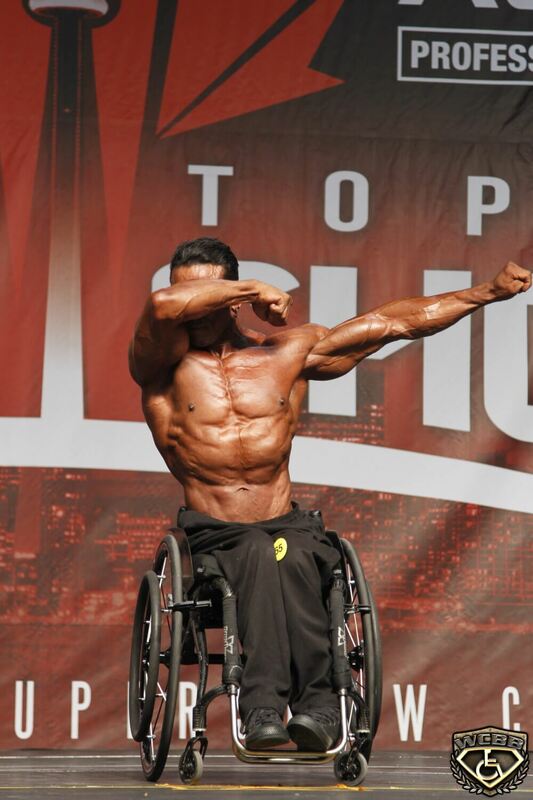 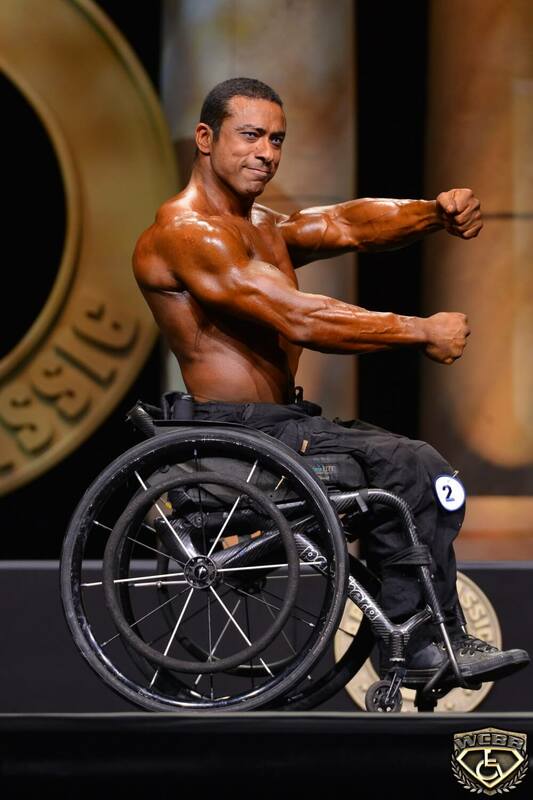 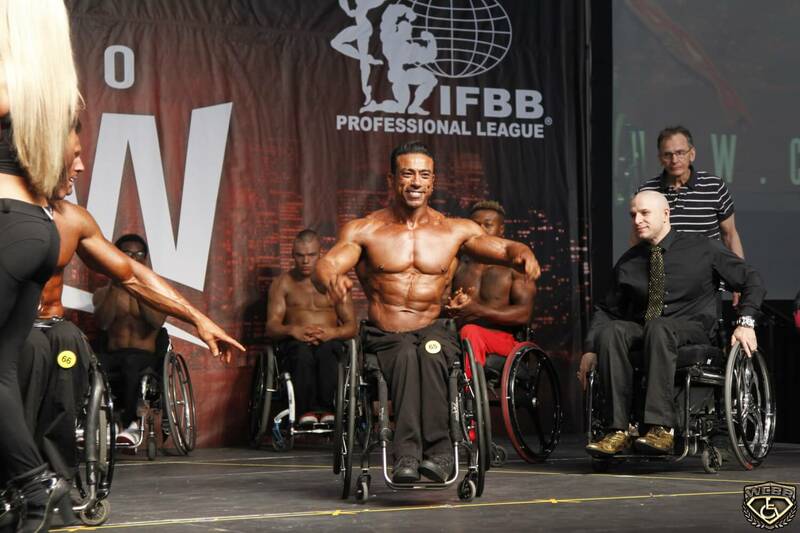 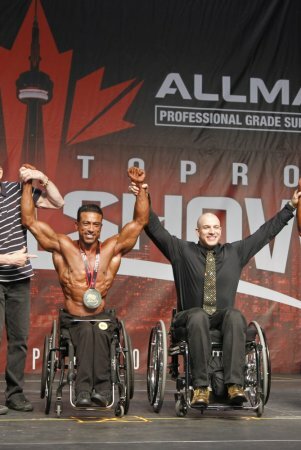 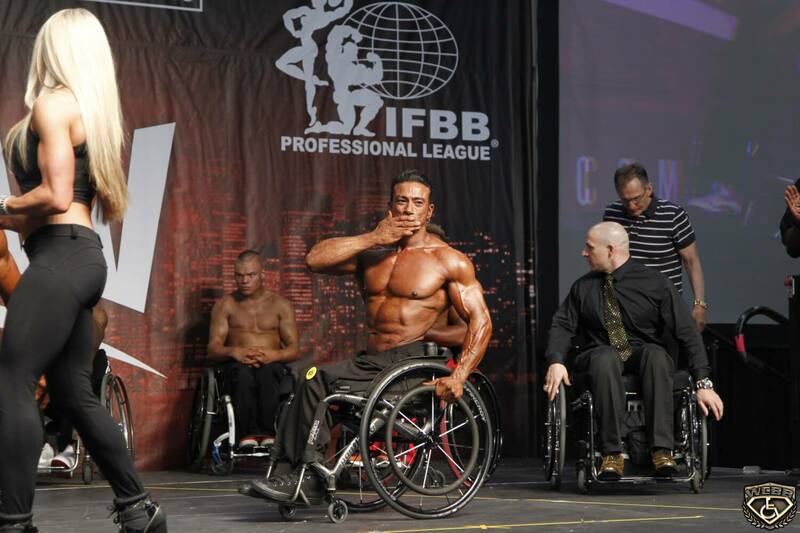 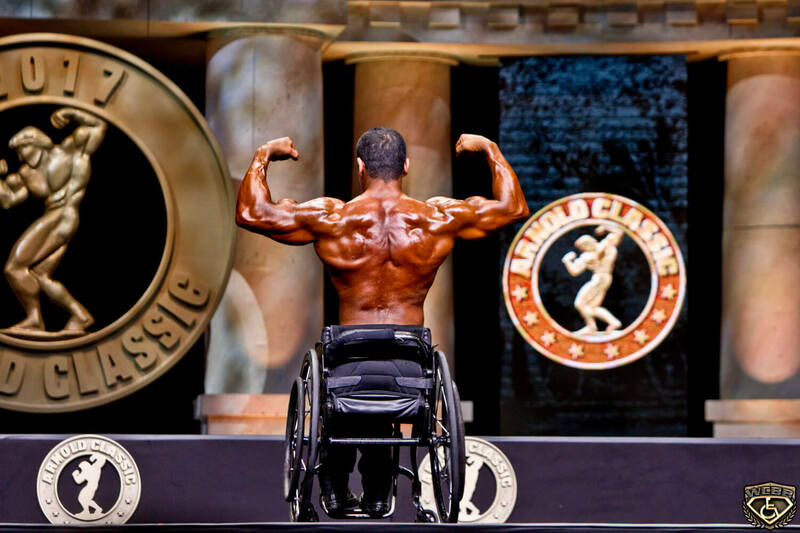 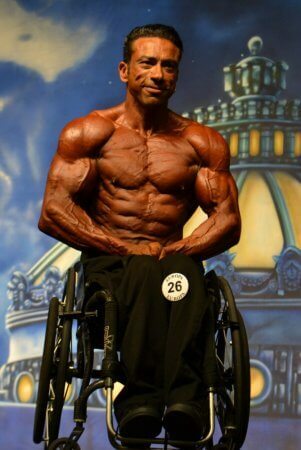 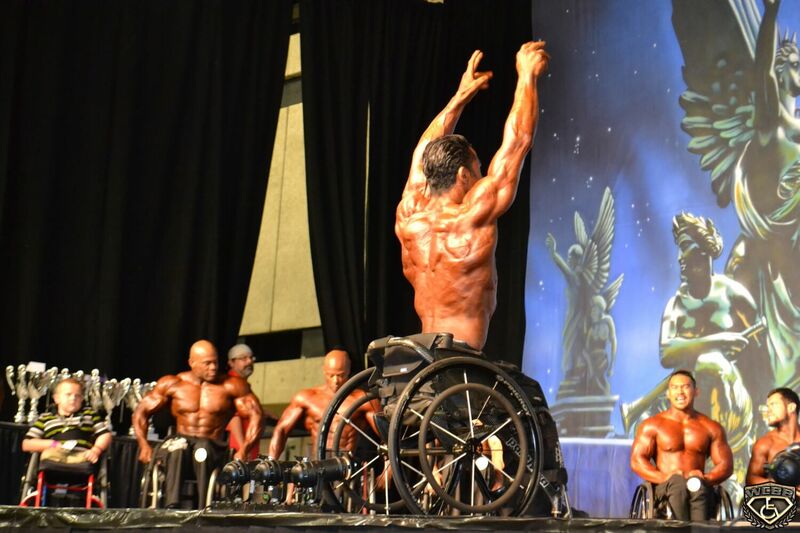 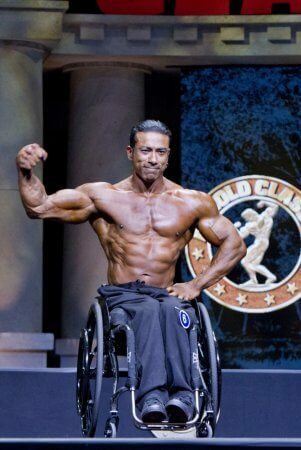 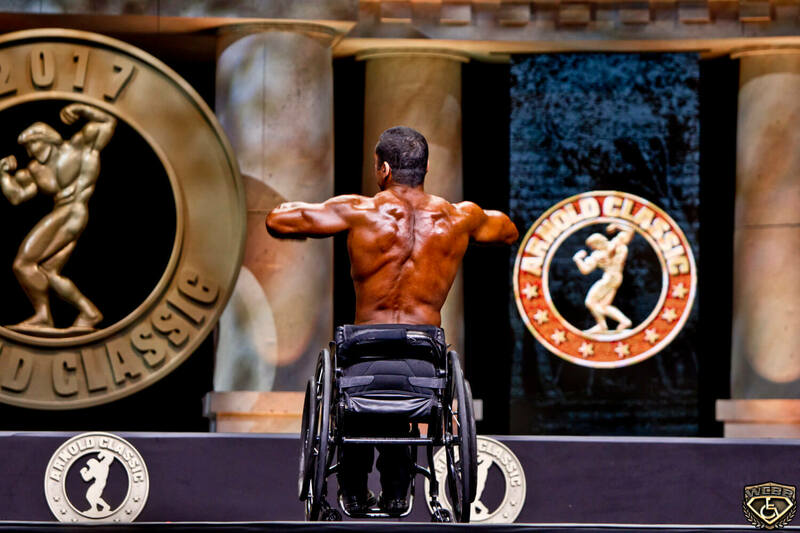 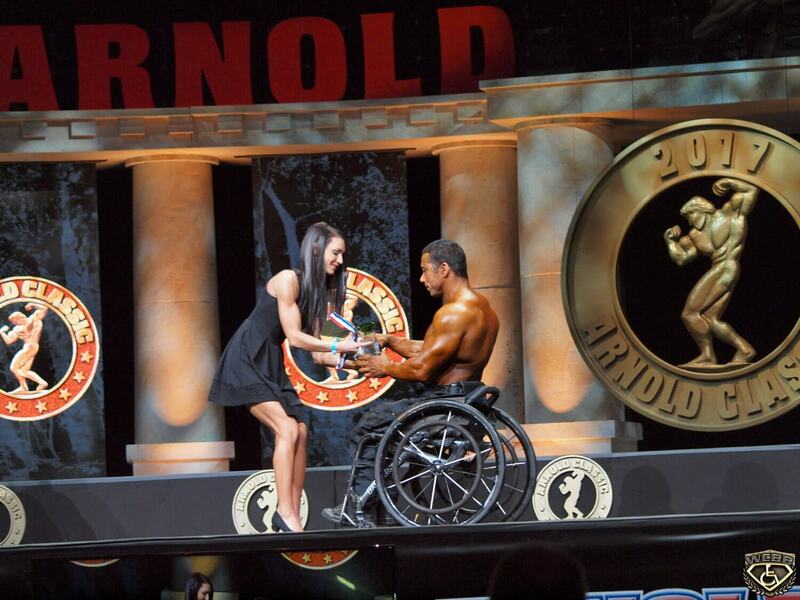 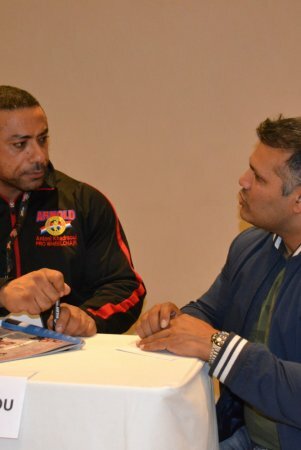 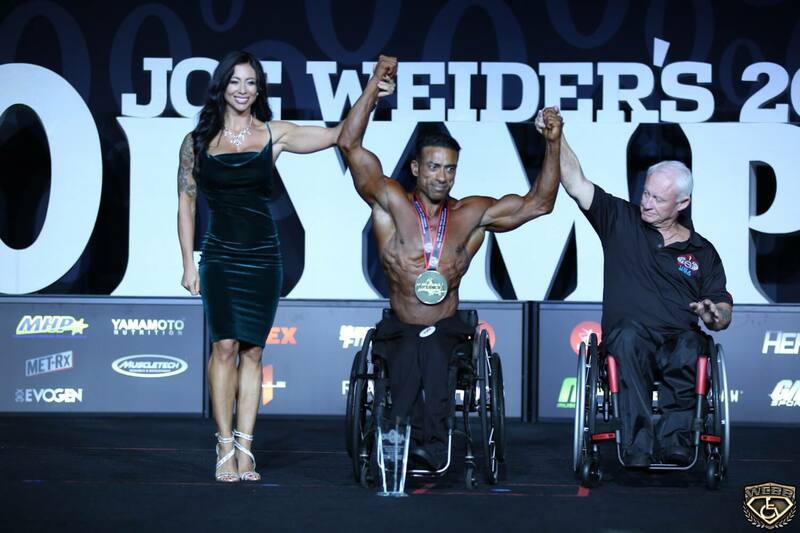 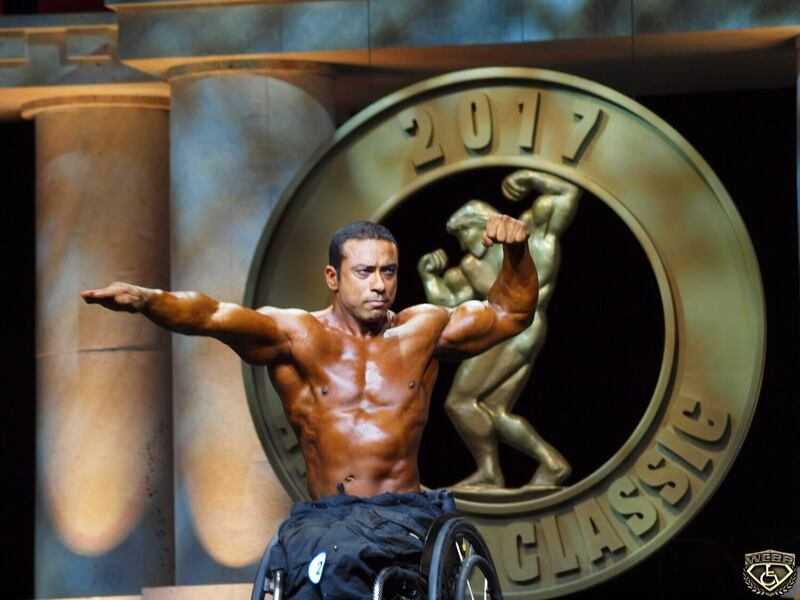 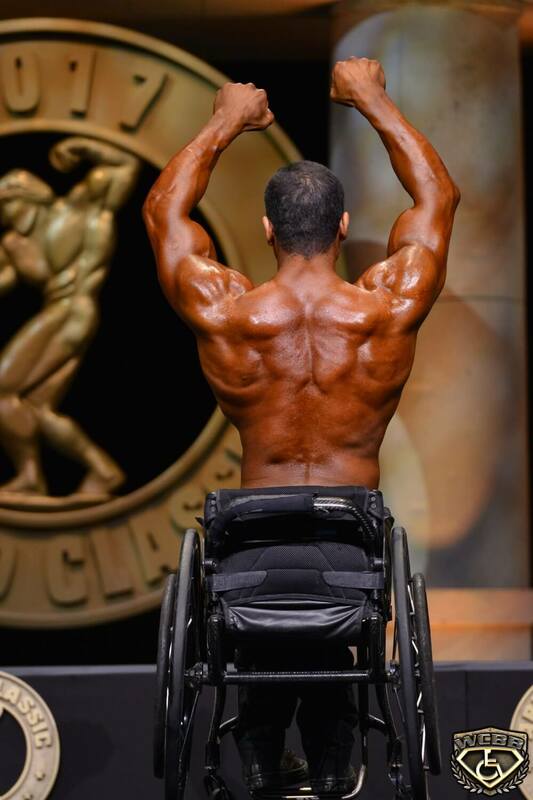 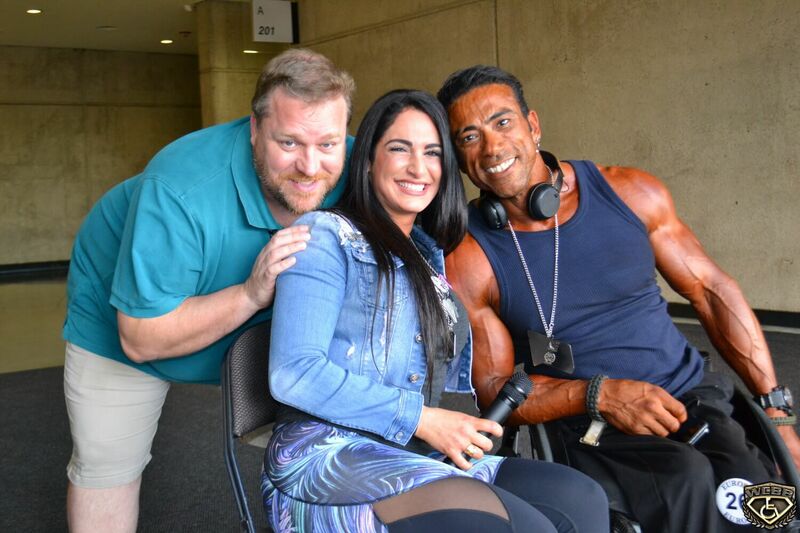 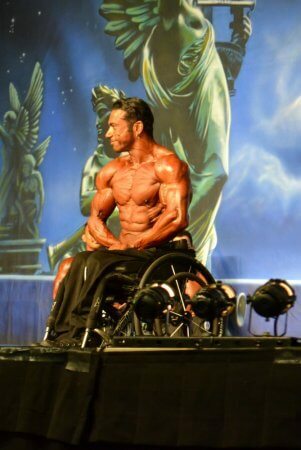 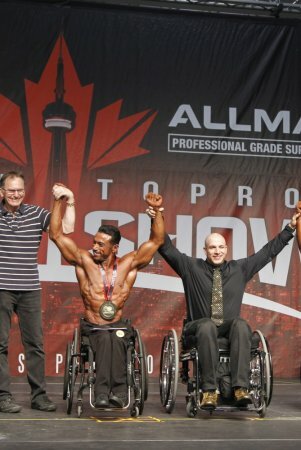 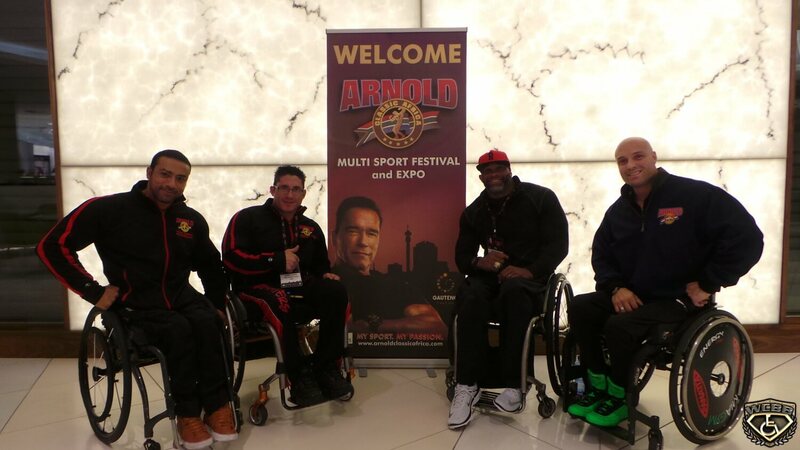 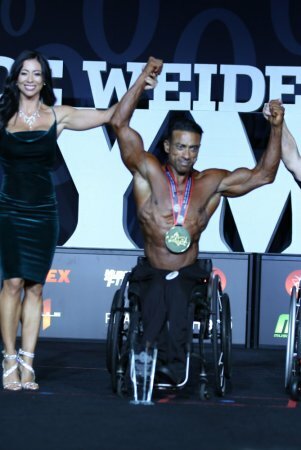 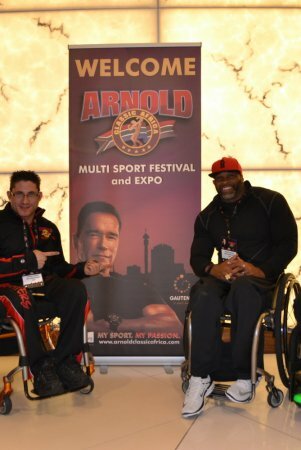 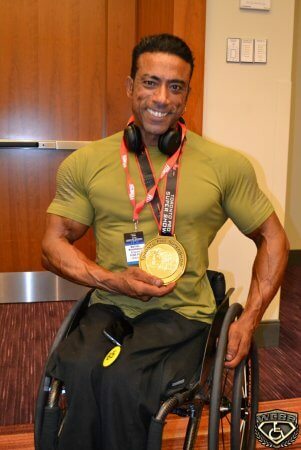 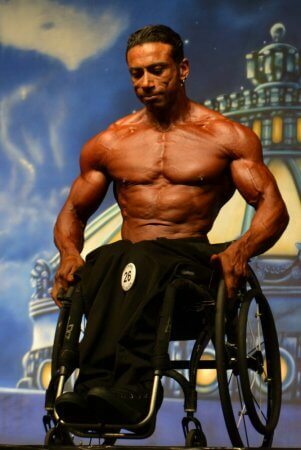 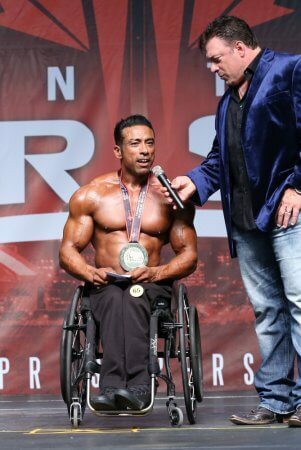 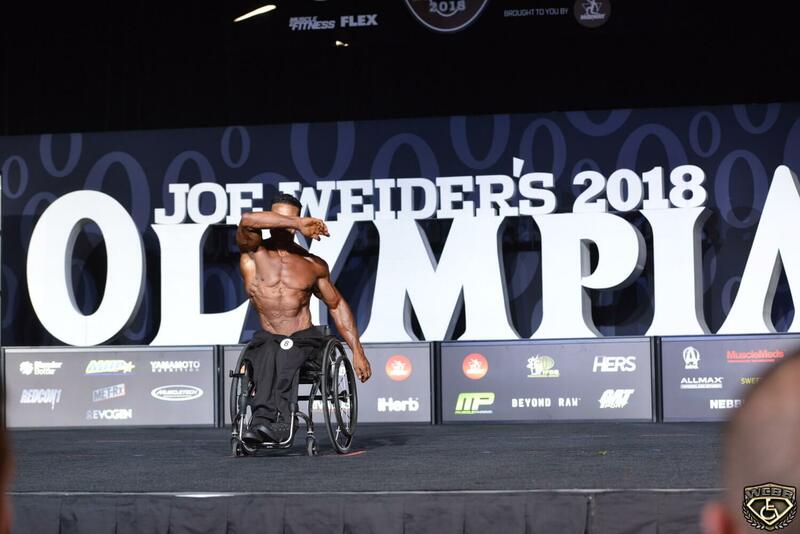 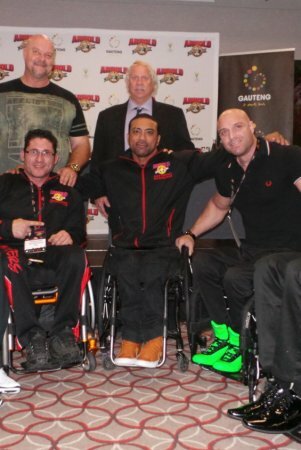 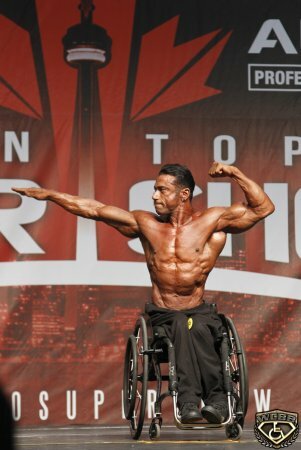 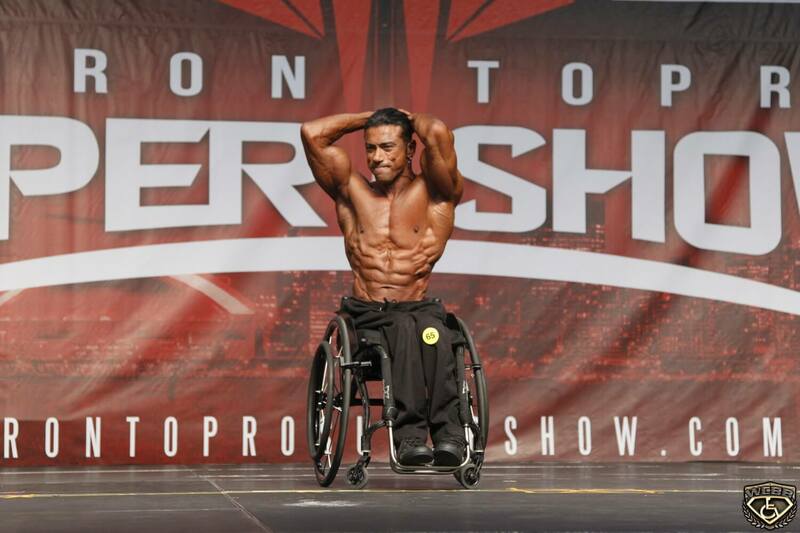 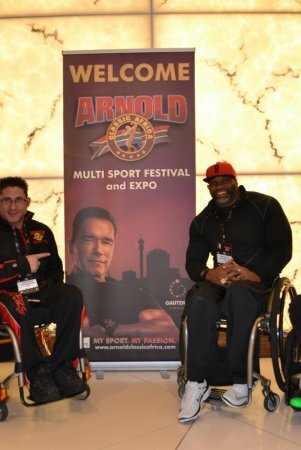 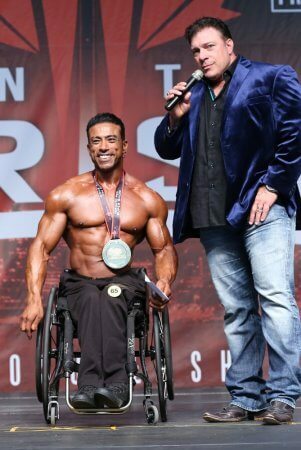 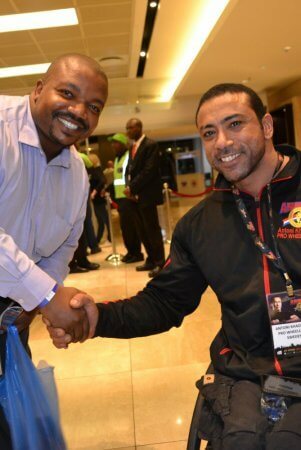 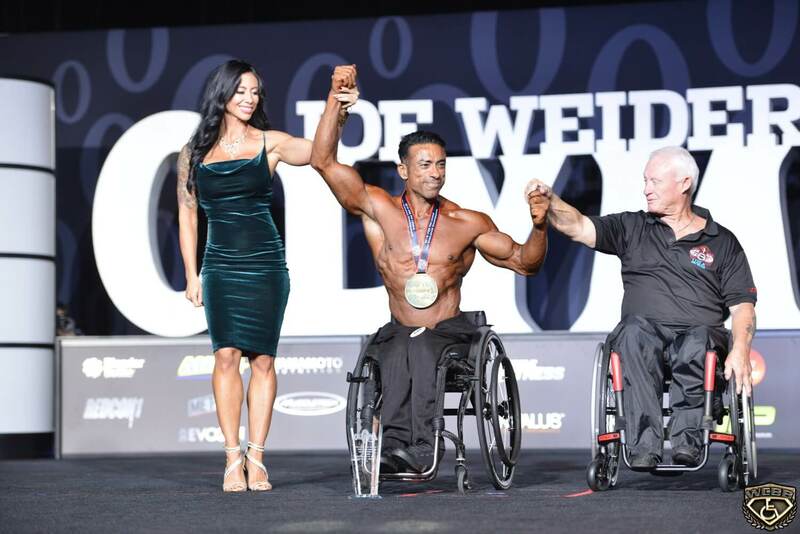 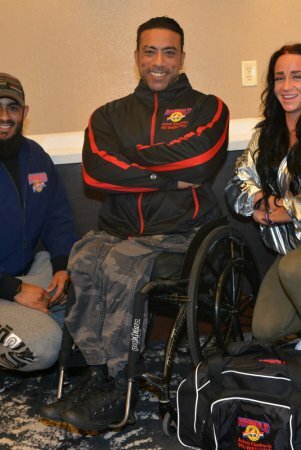 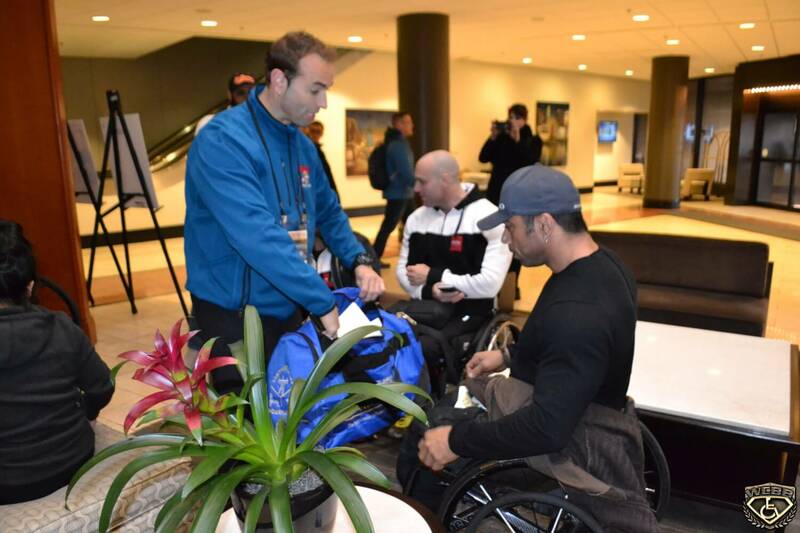 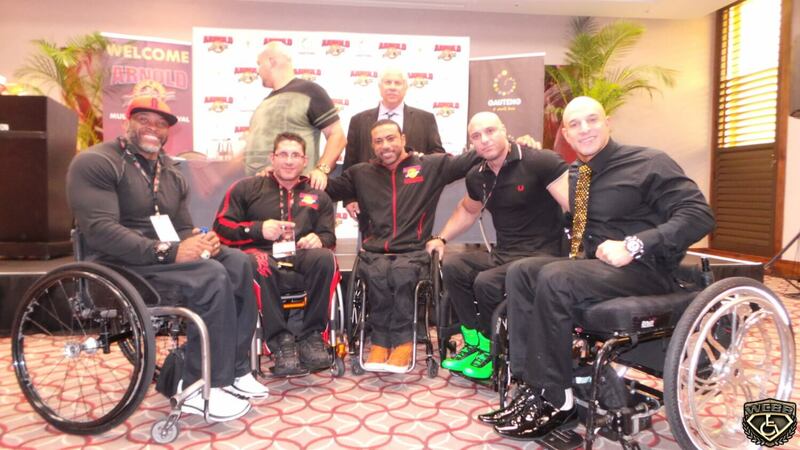 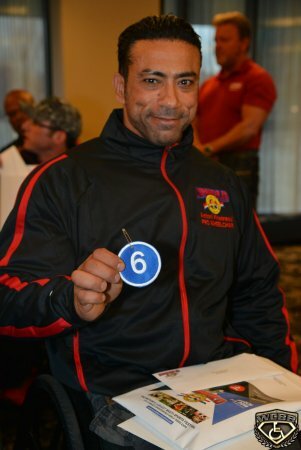 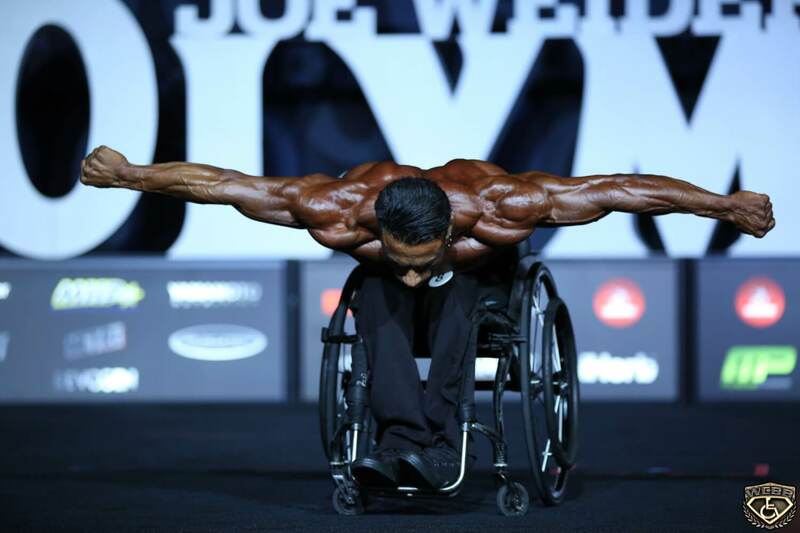 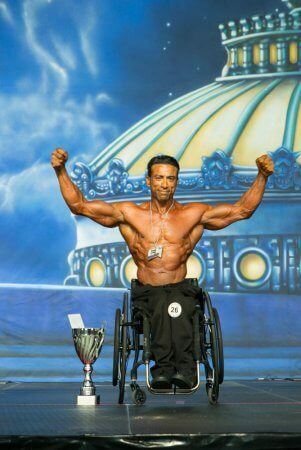 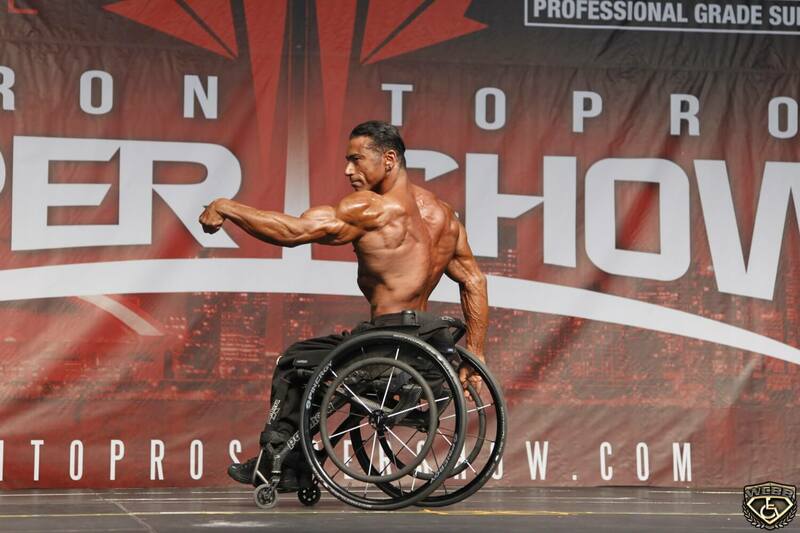 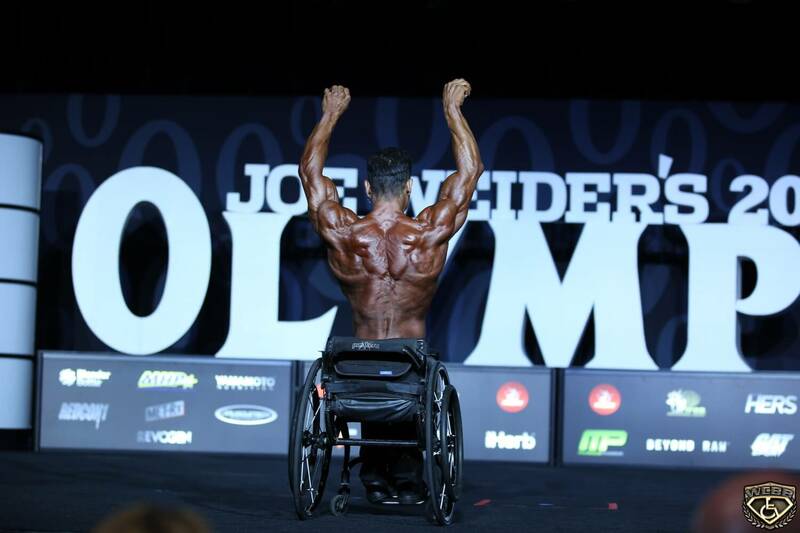 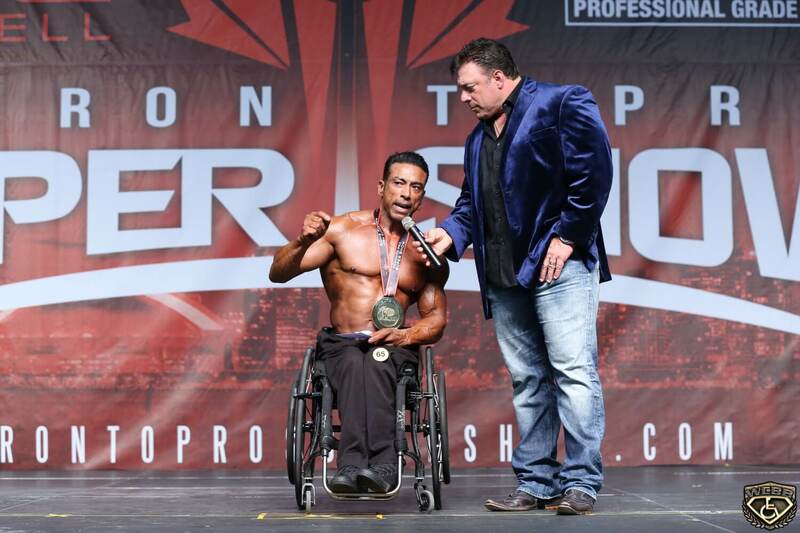 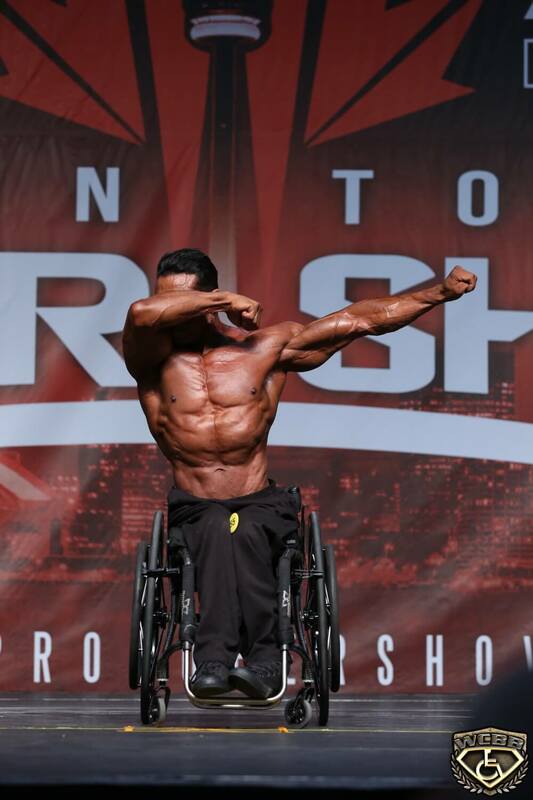 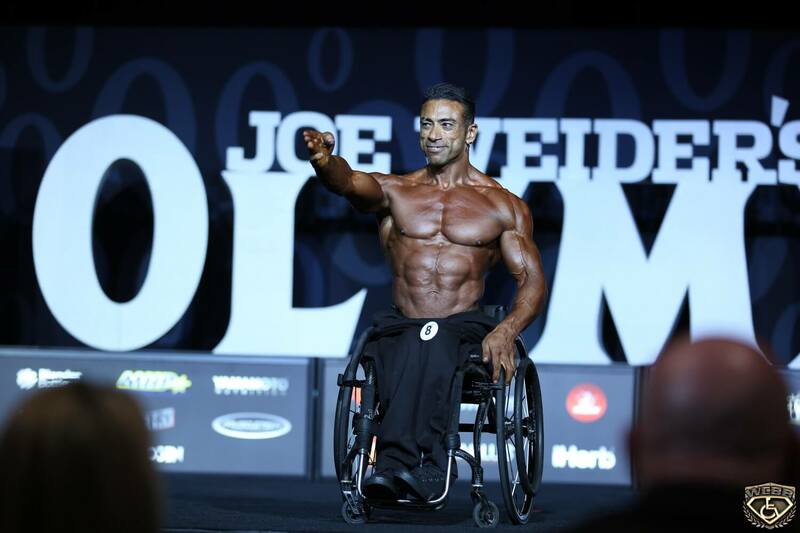 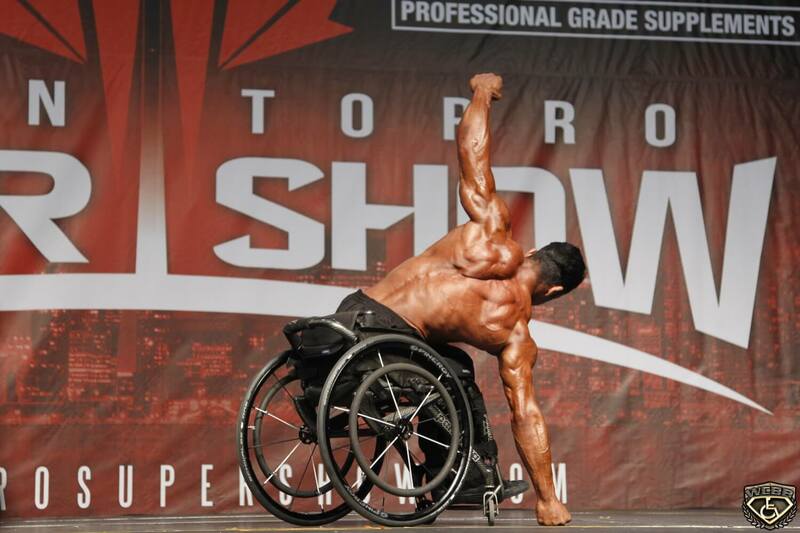 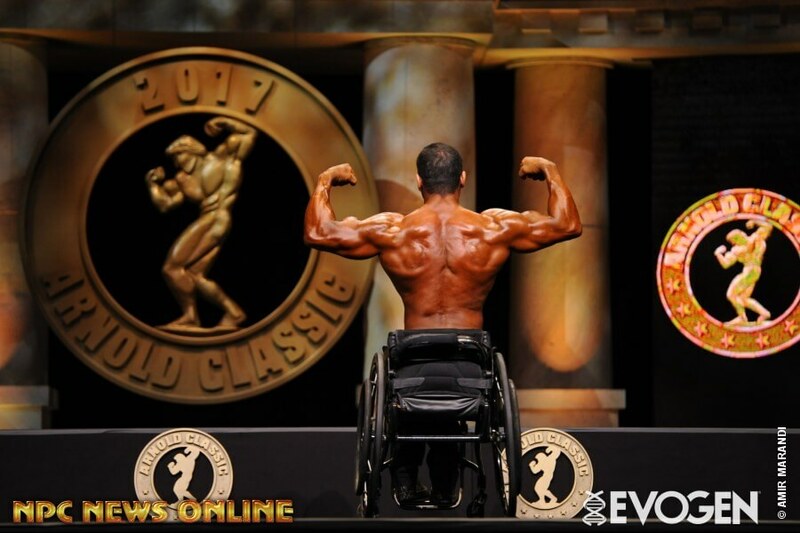 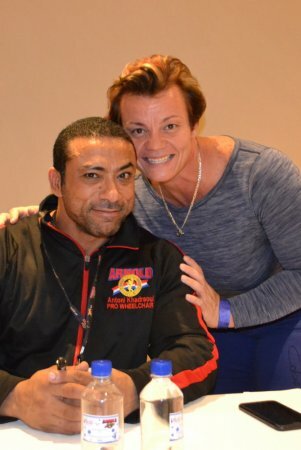 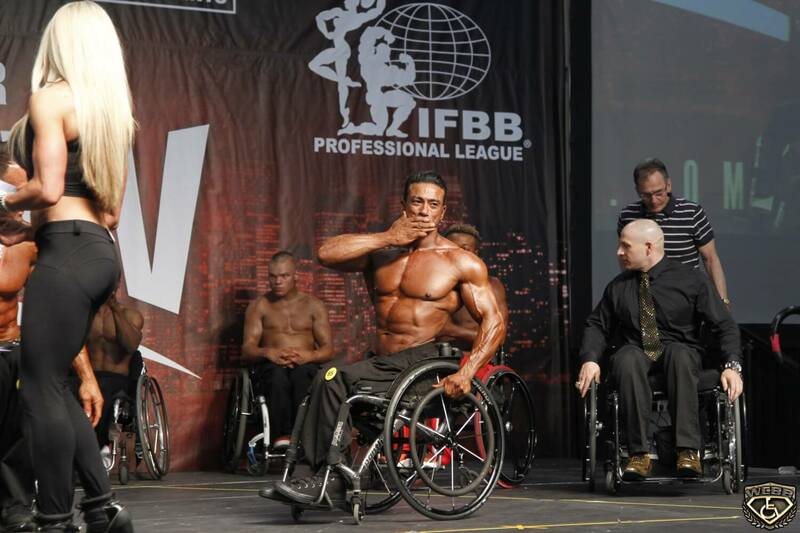 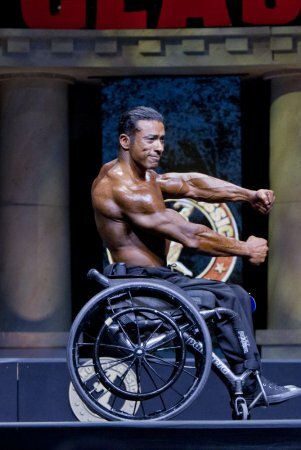 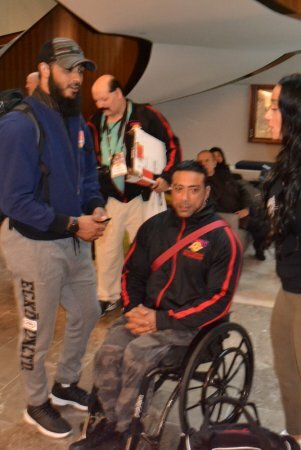 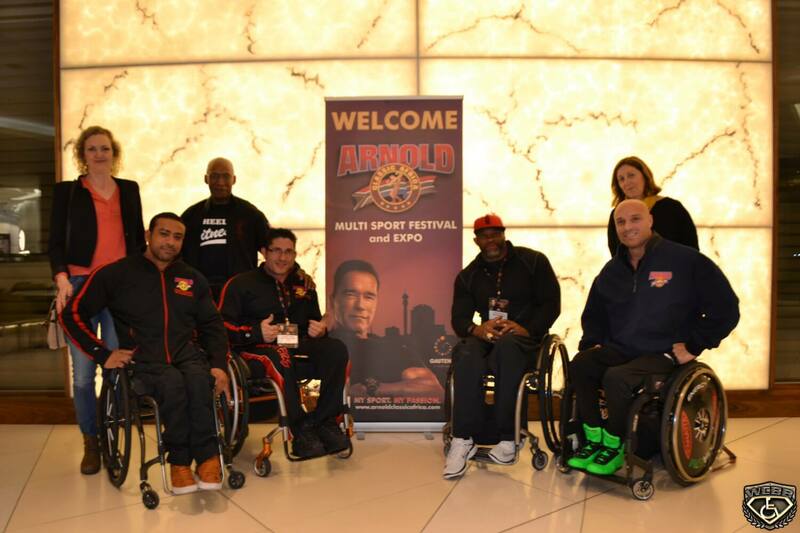 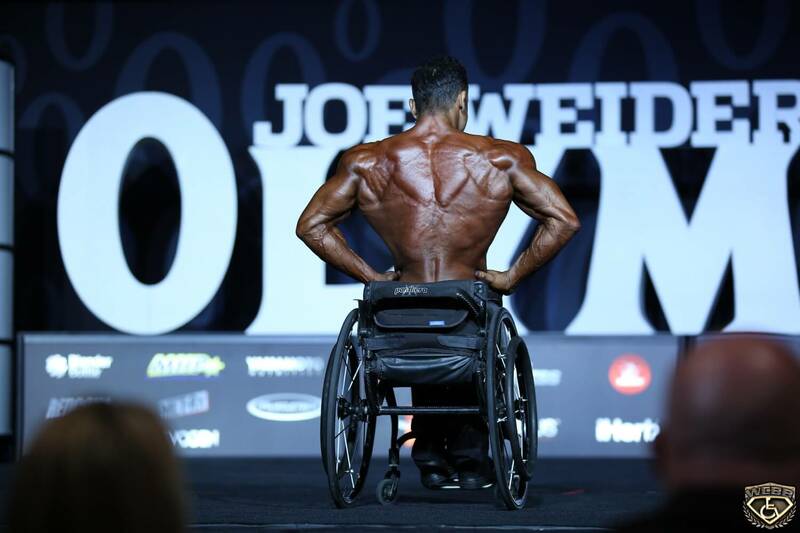 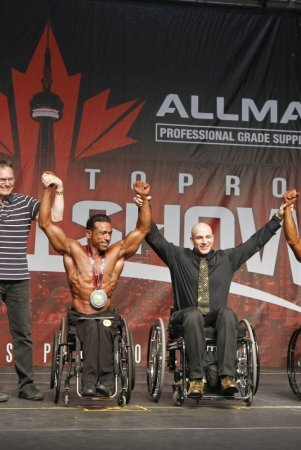 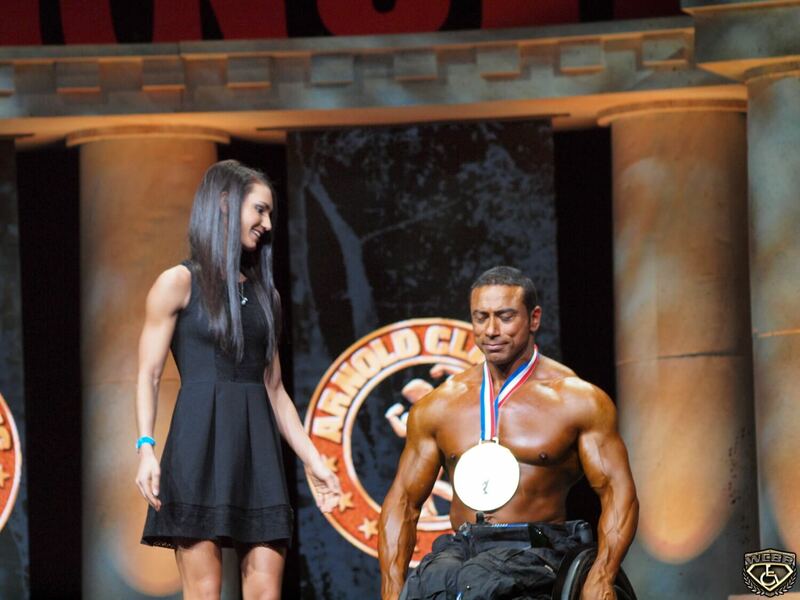 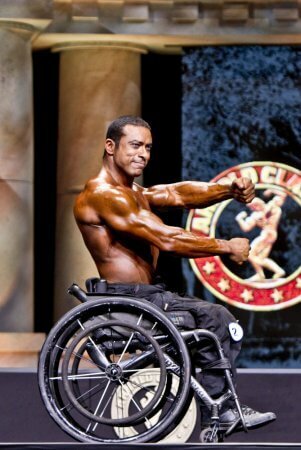 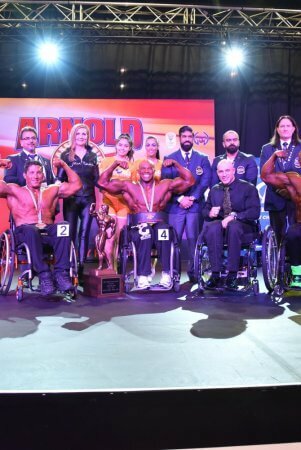 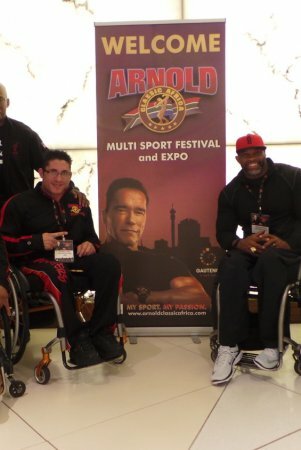 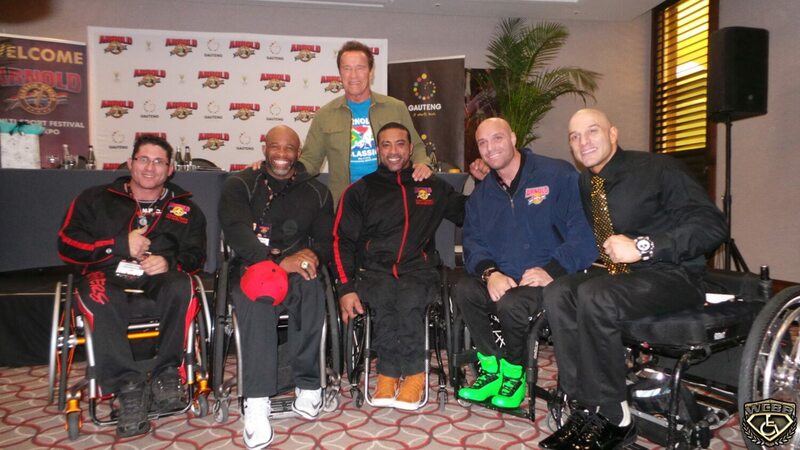 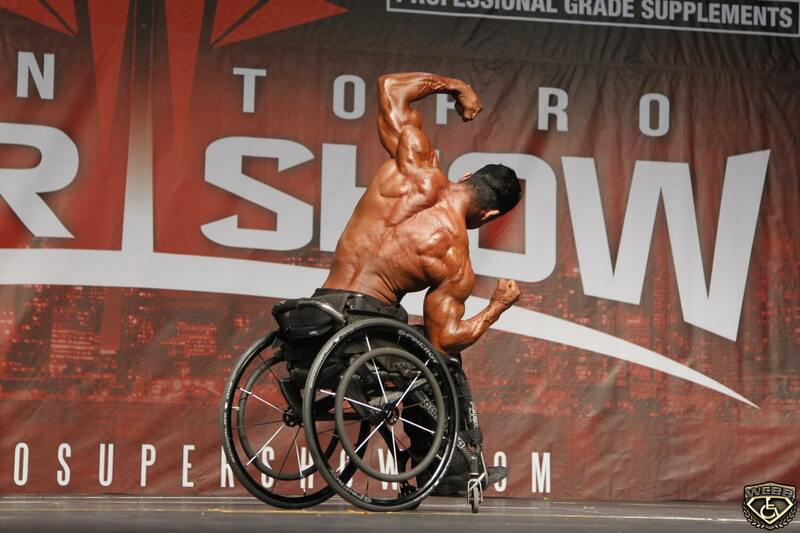 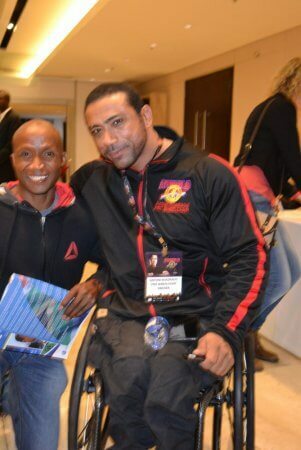 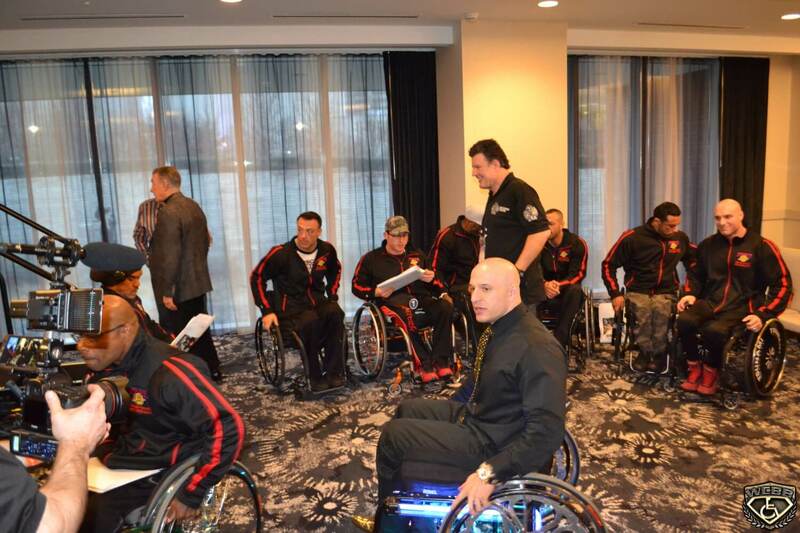 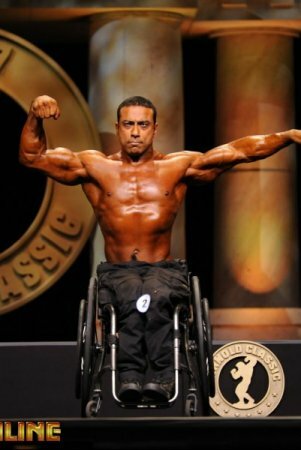 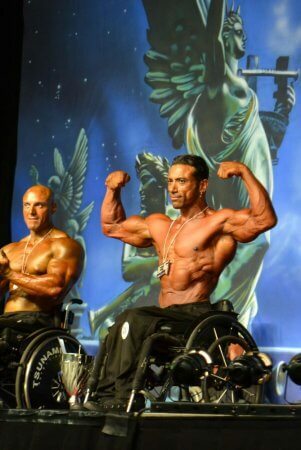 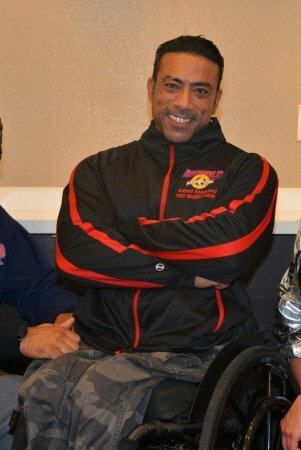 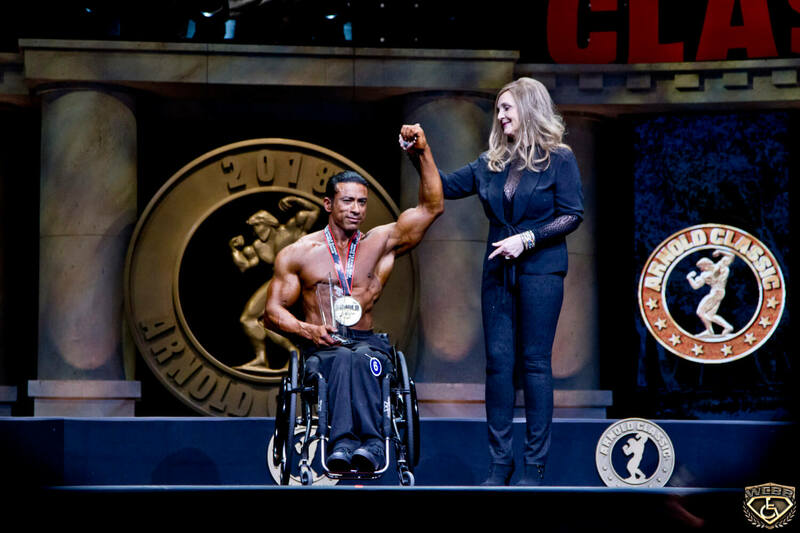 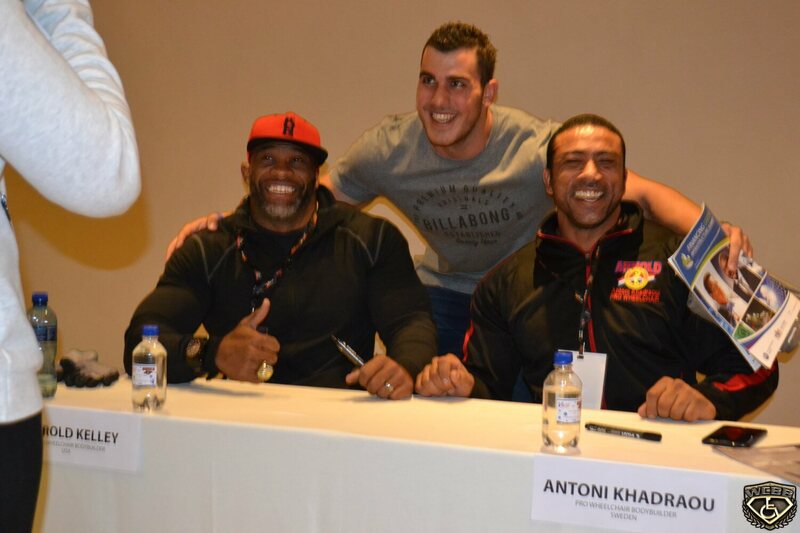 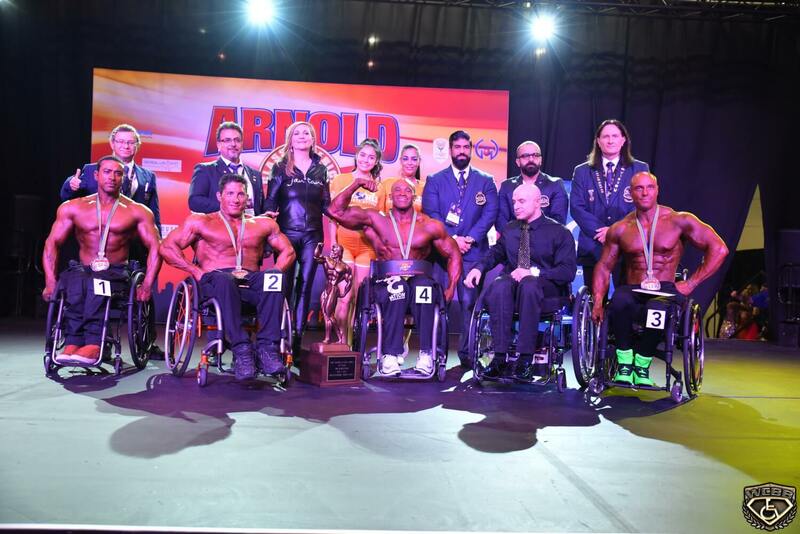 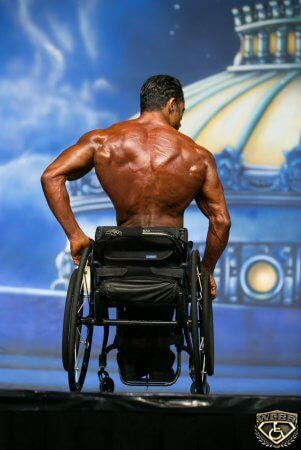 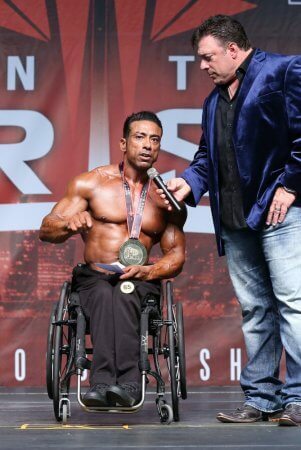 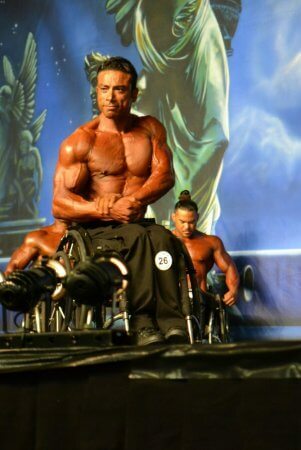 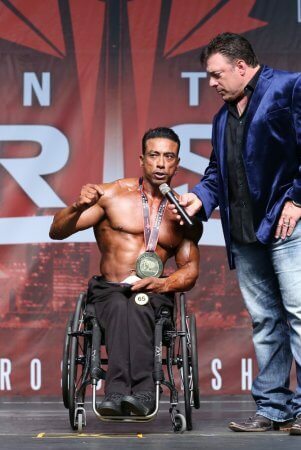 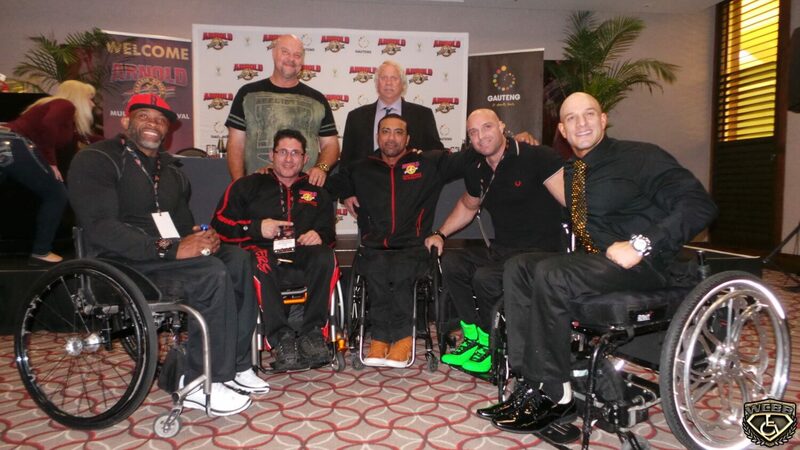 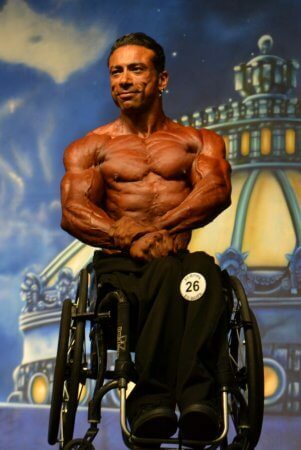 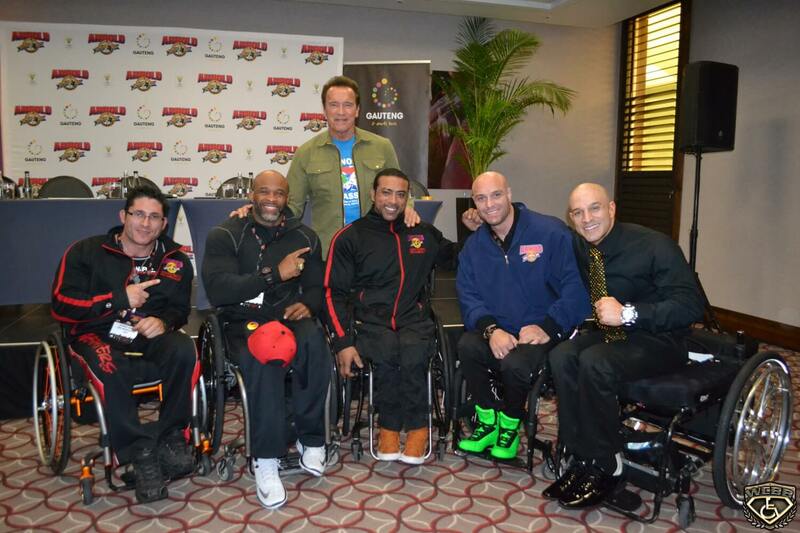 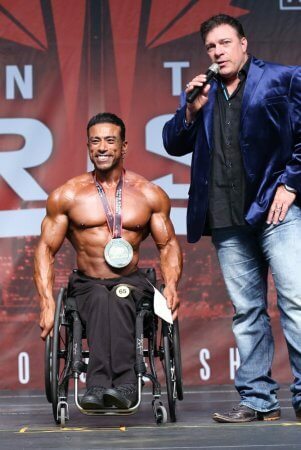 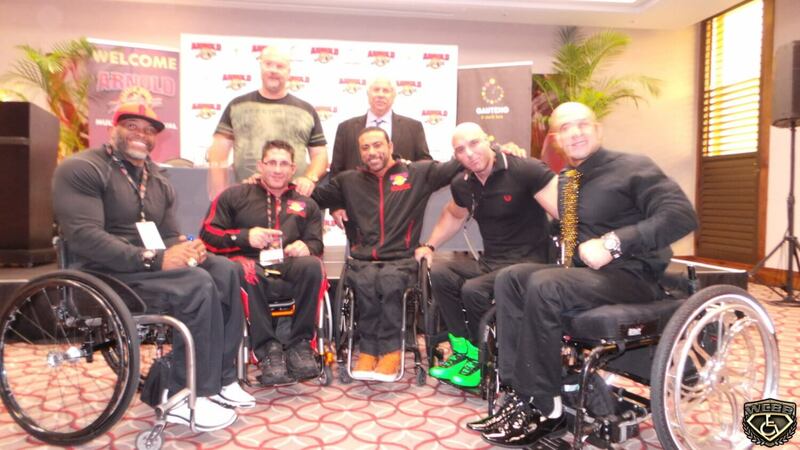 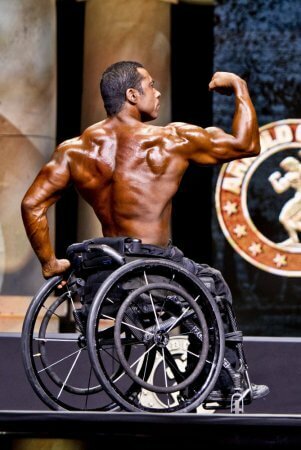 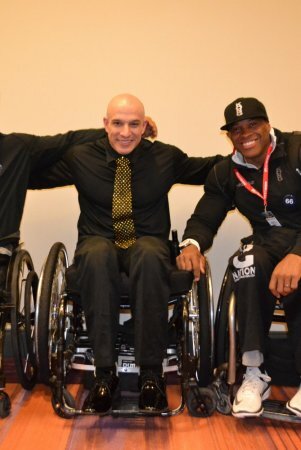 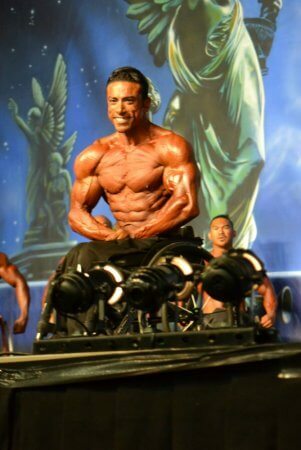 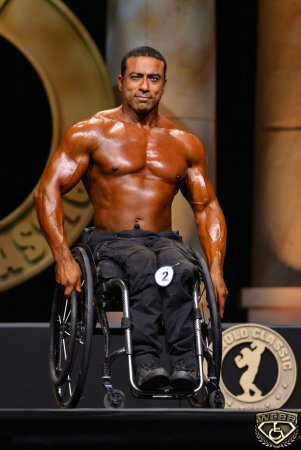 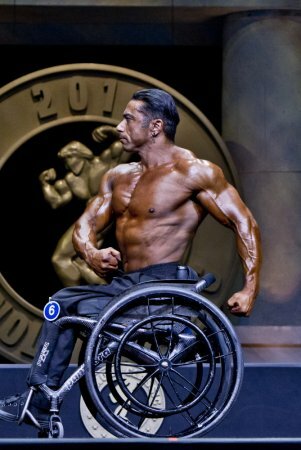 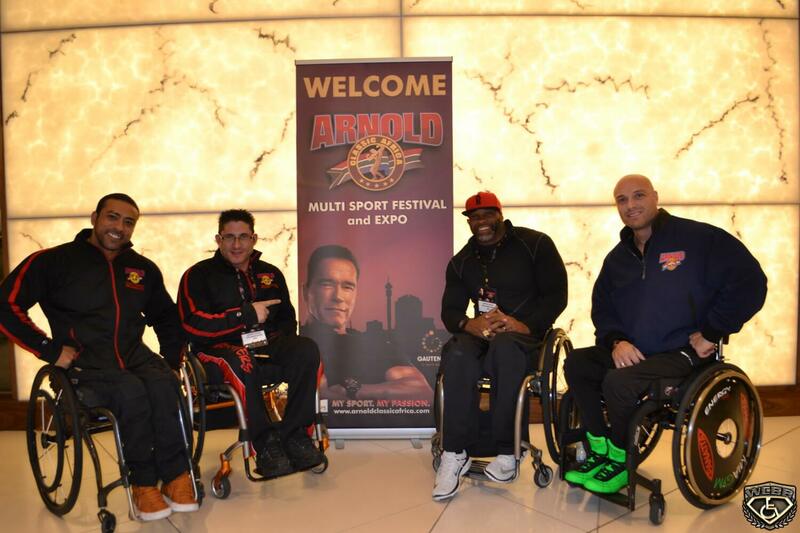 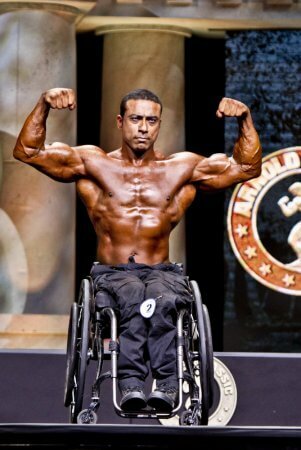 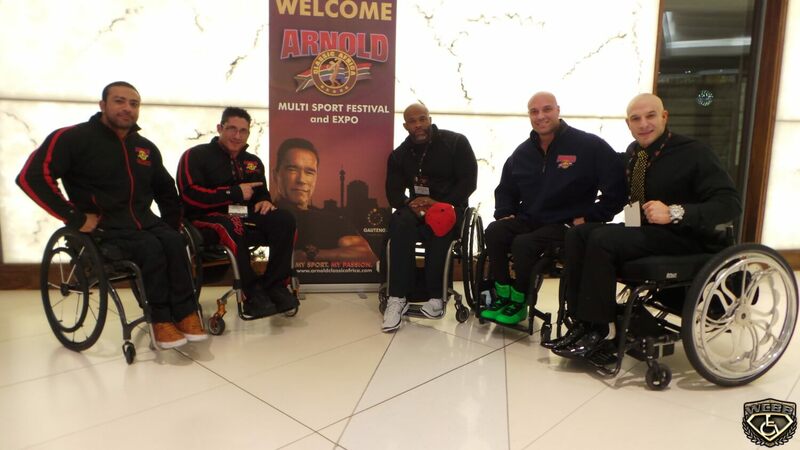 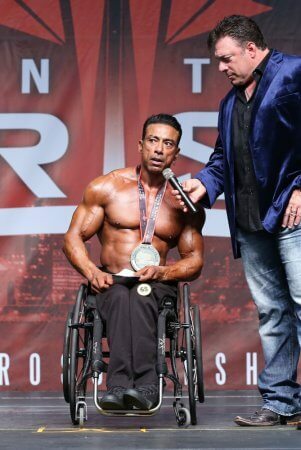 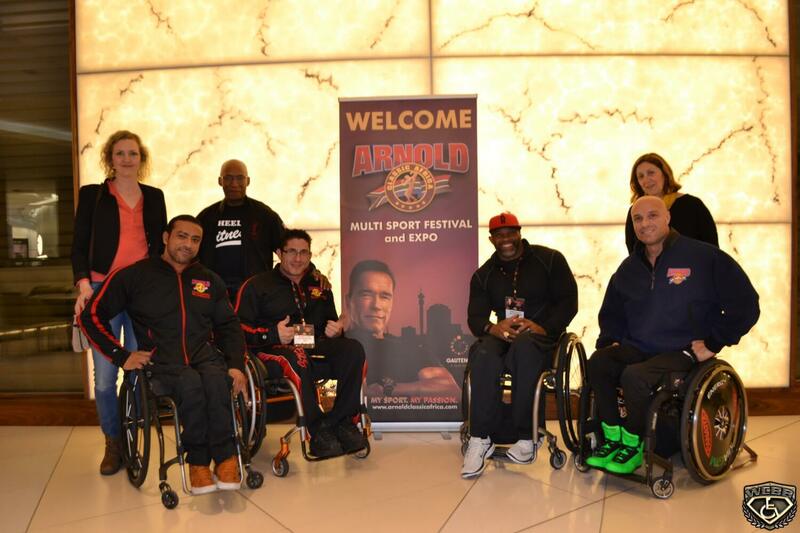 Antoni is the first wheelchair bodybuilder from his country making Sweden very proud of his huge accomplishments. 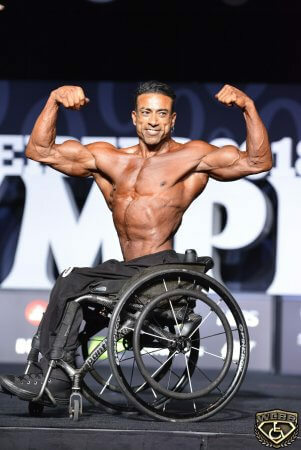 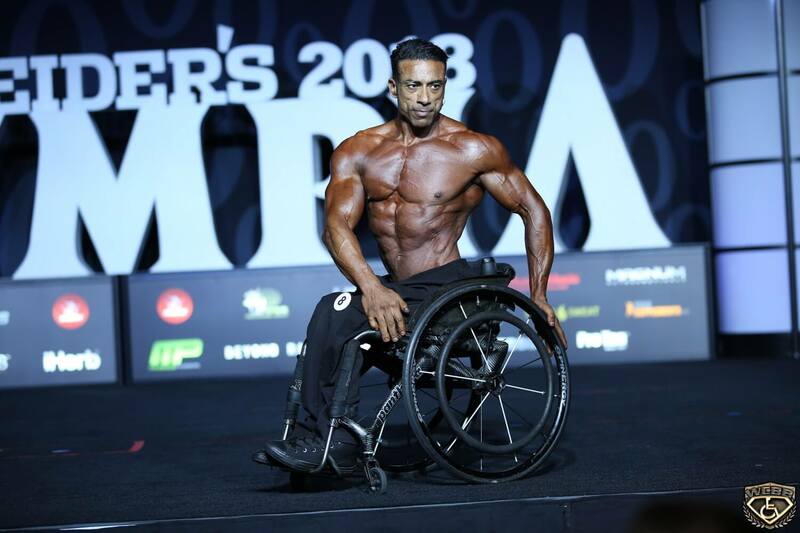 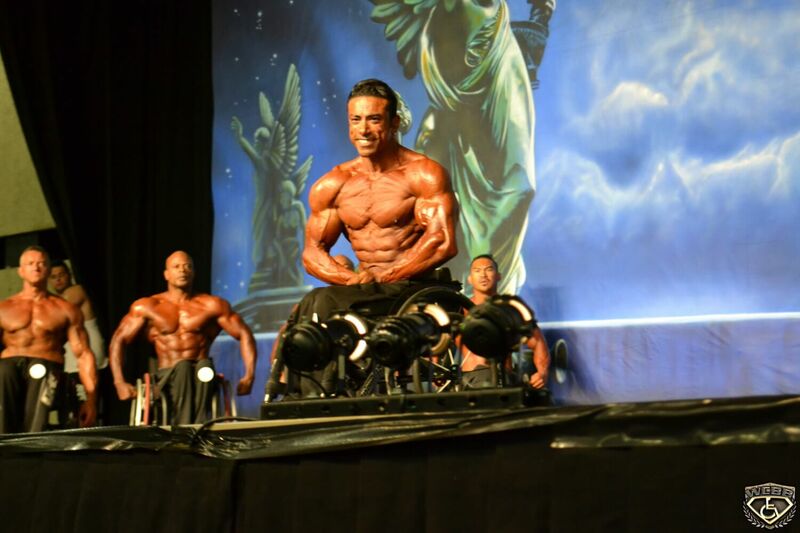 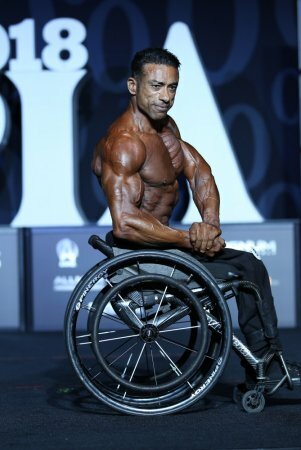 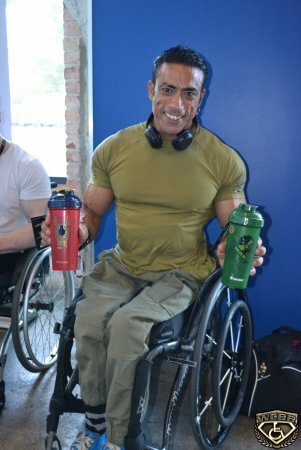 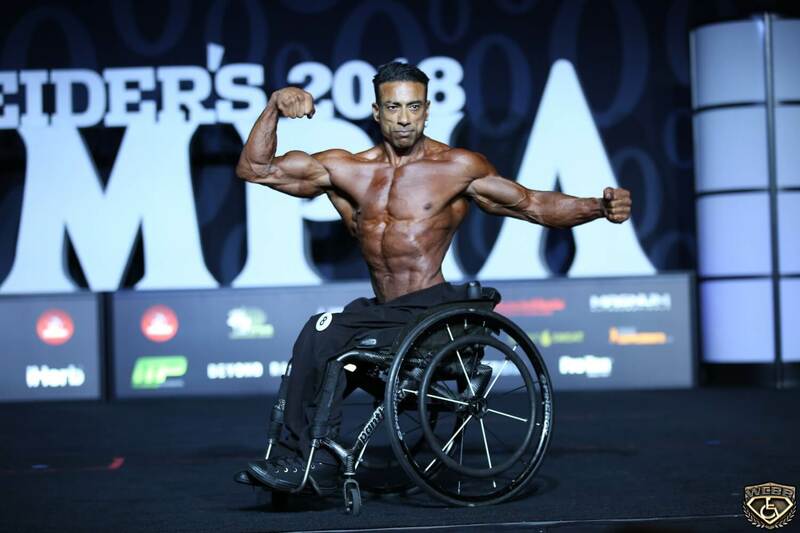 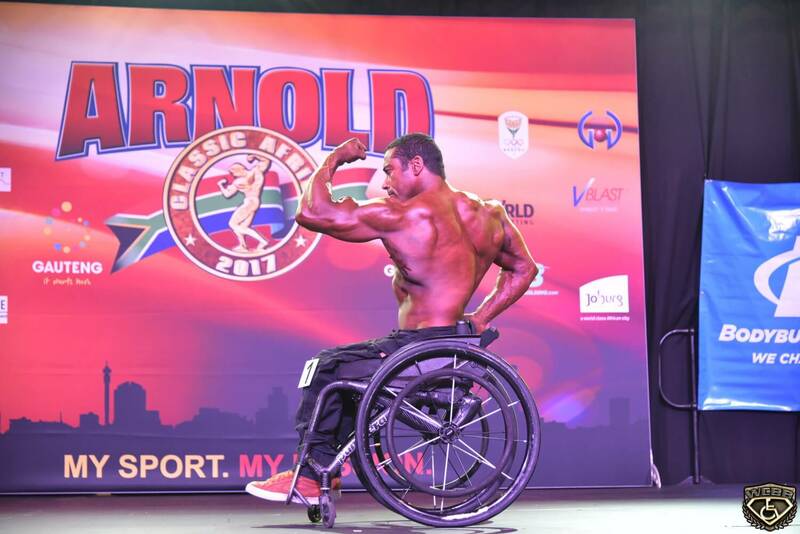 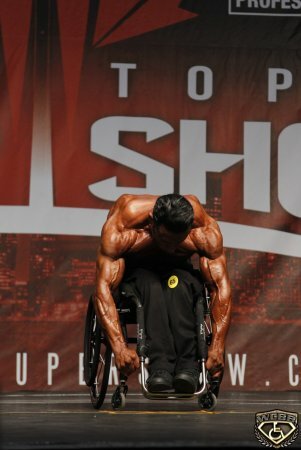 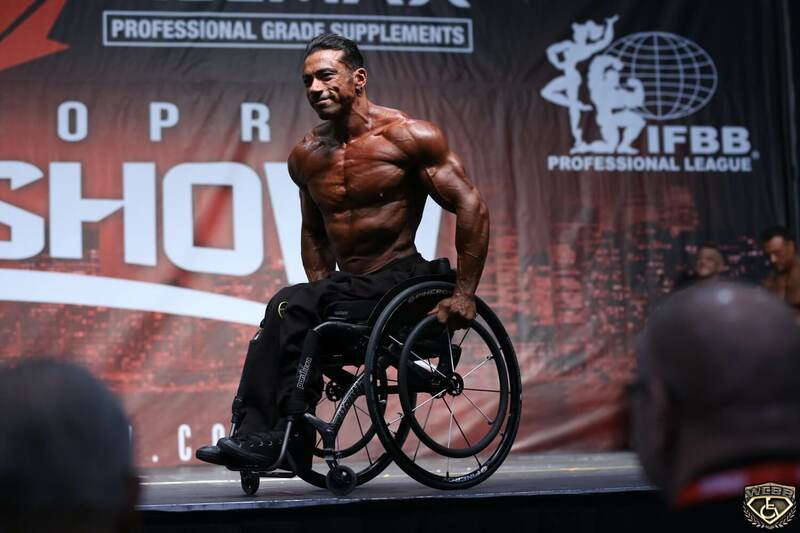 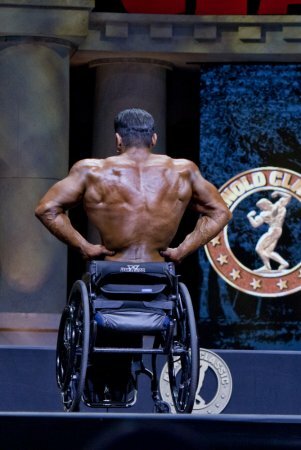 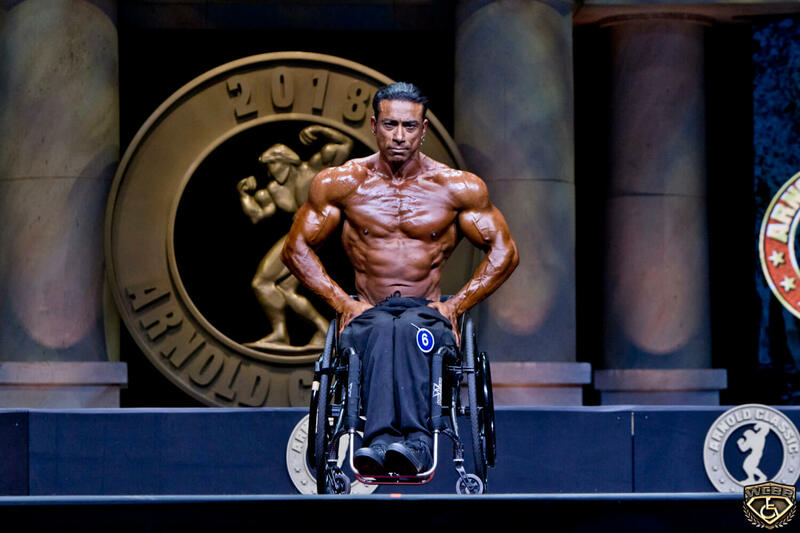 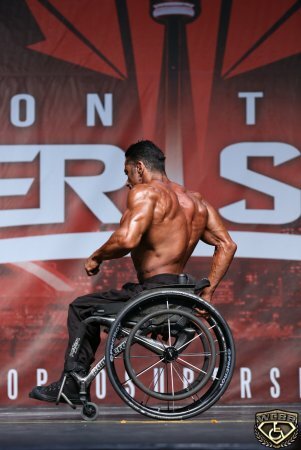 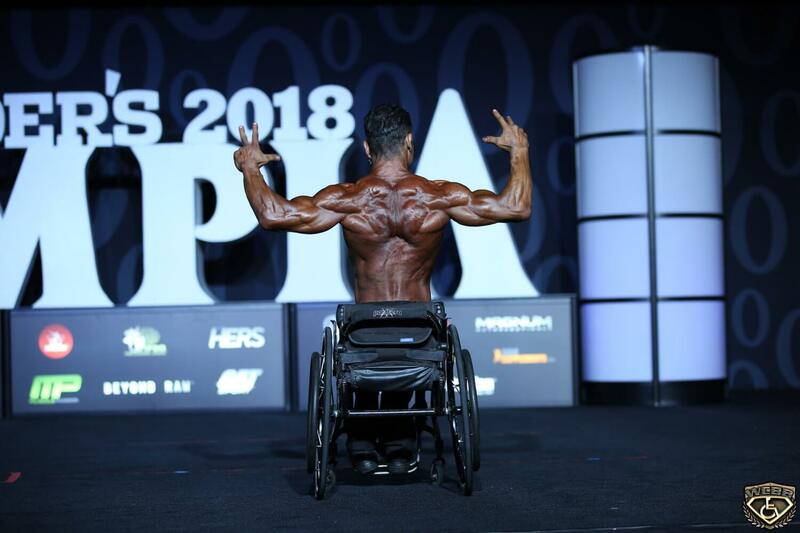 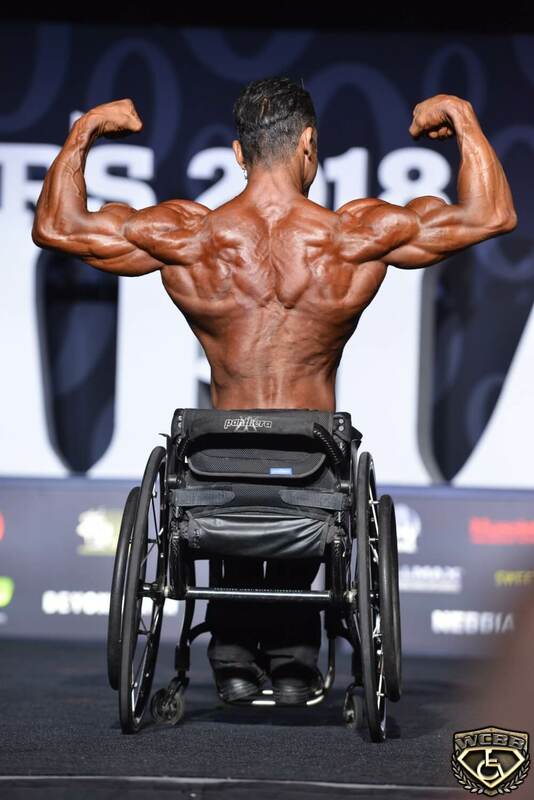 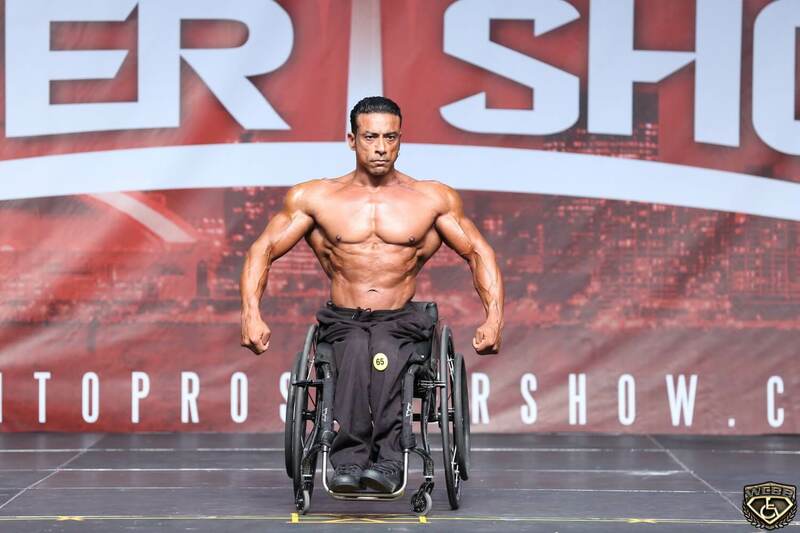 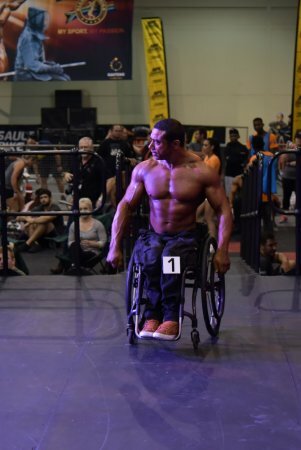 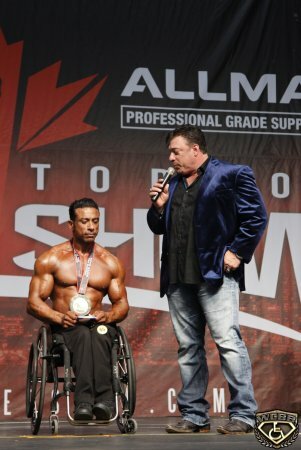 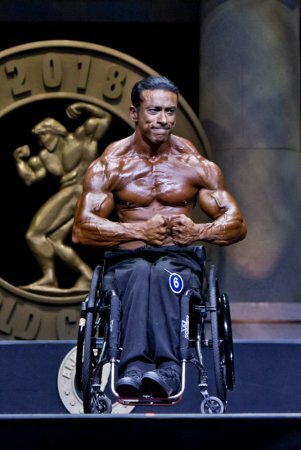 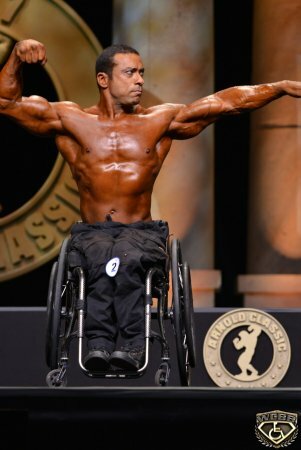 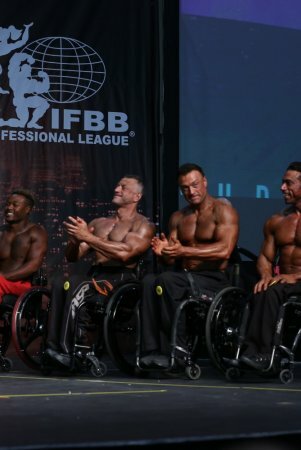 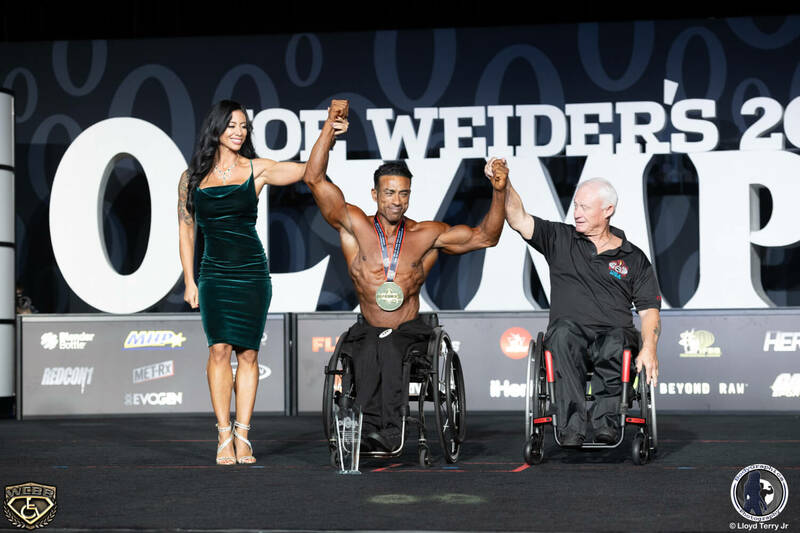 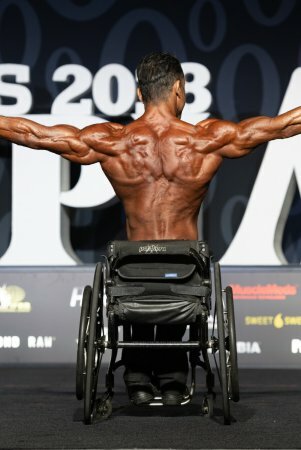 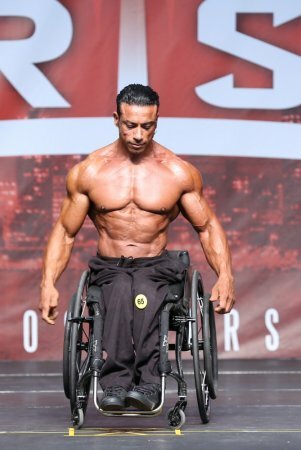 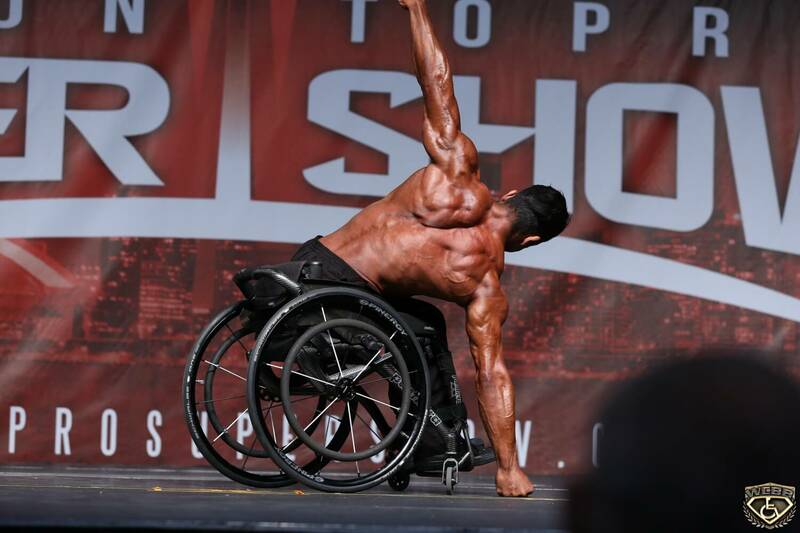 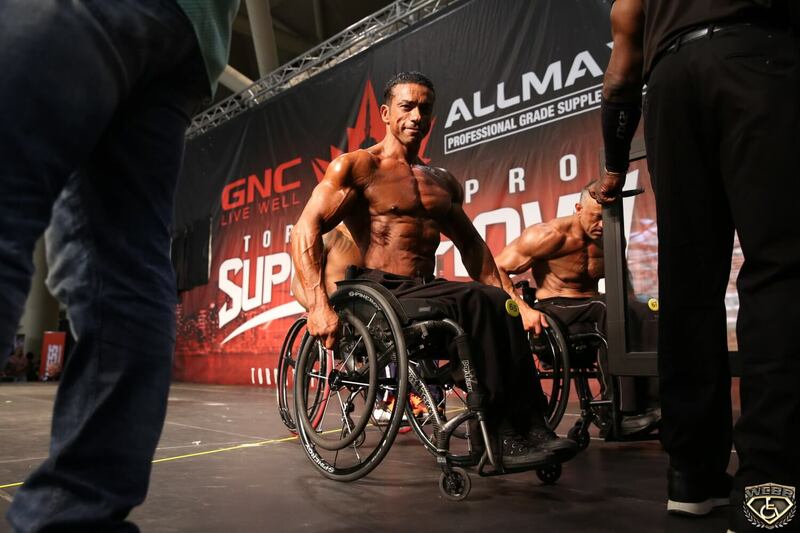 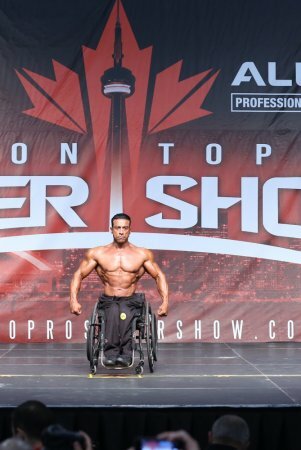 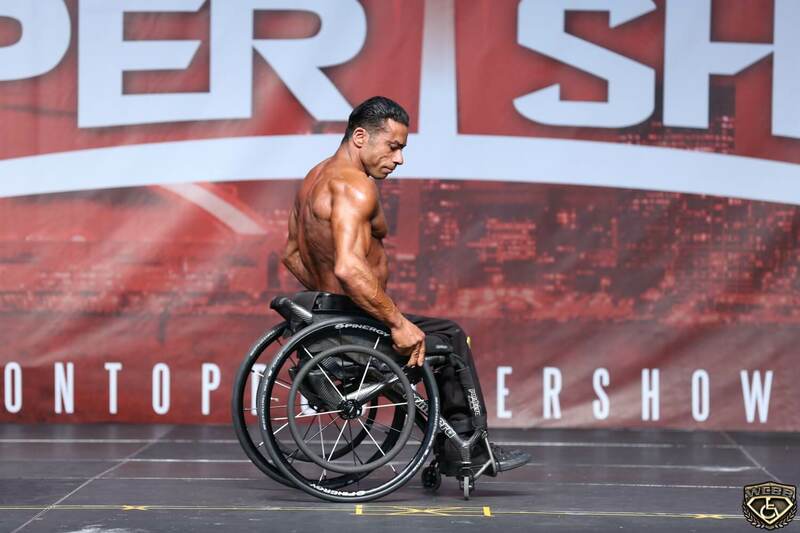 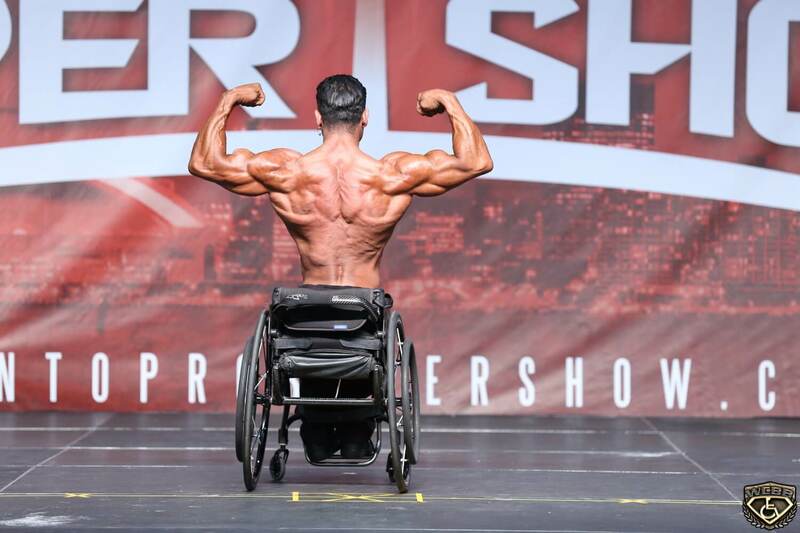 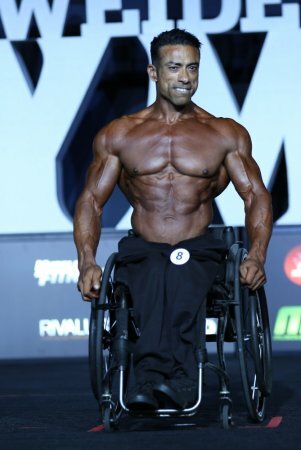 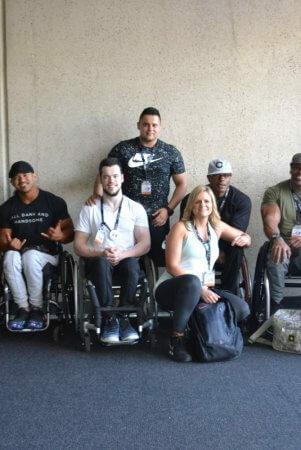 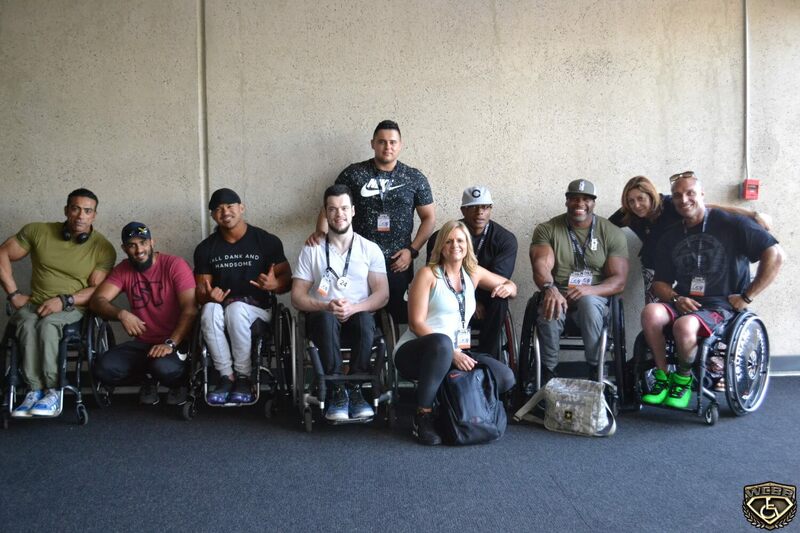 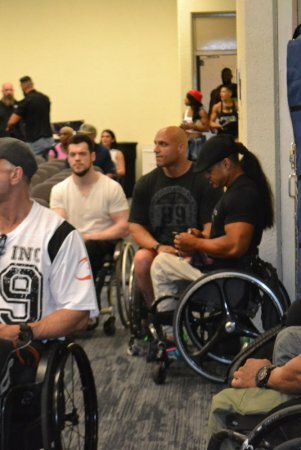 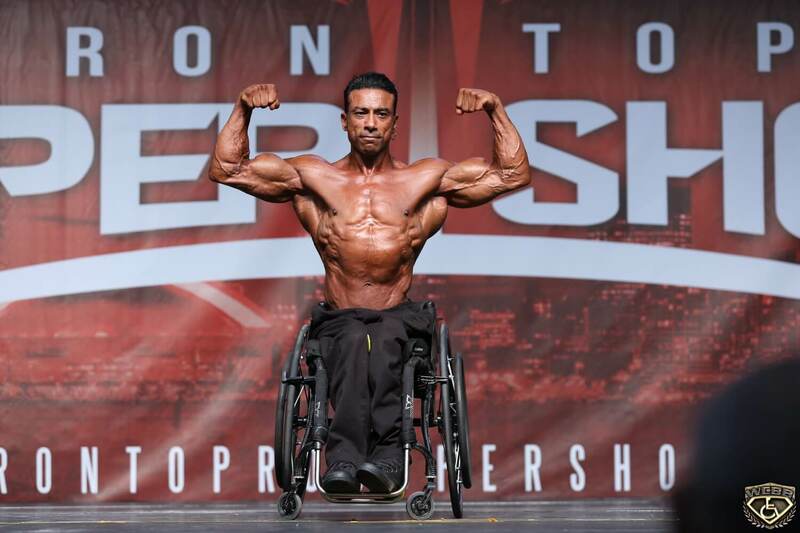 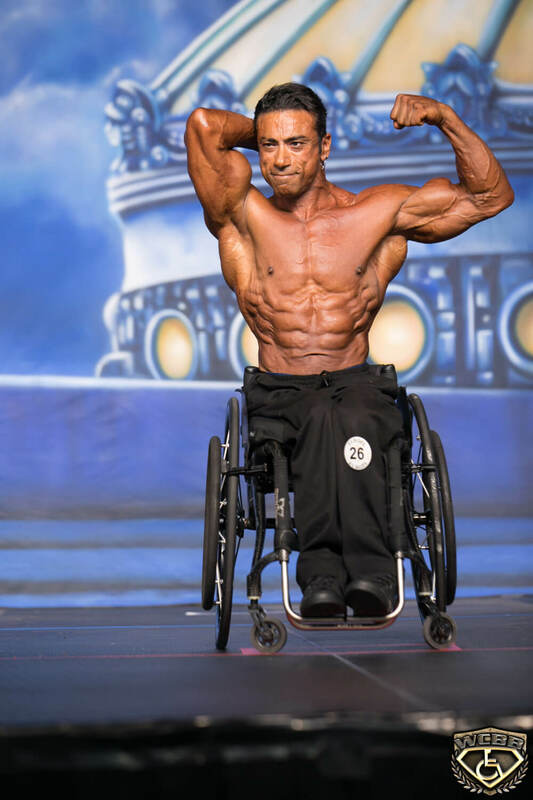 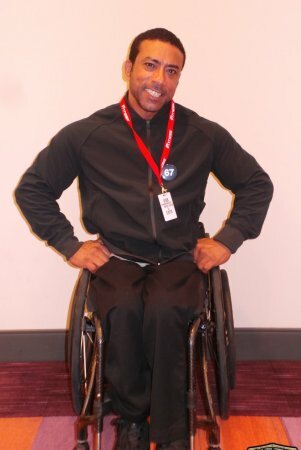 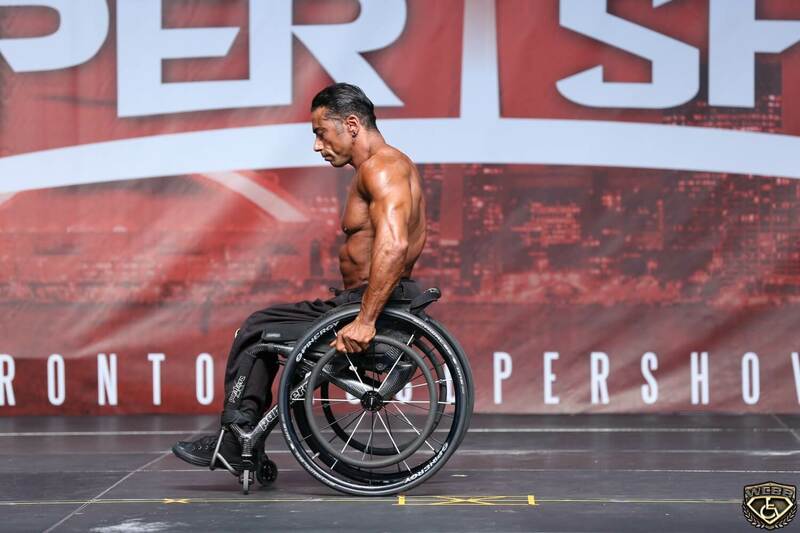 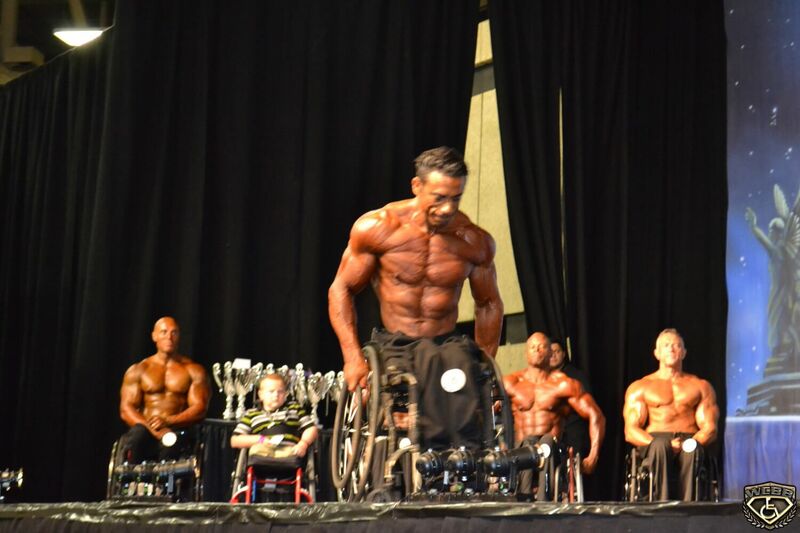 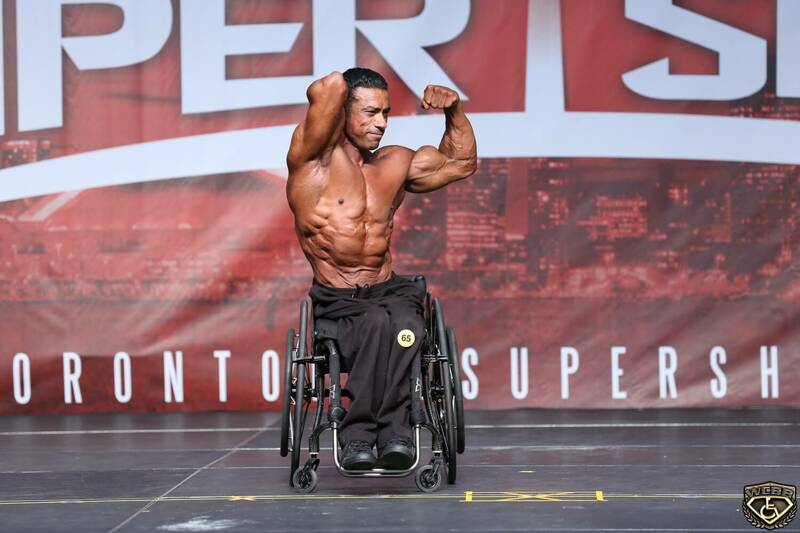 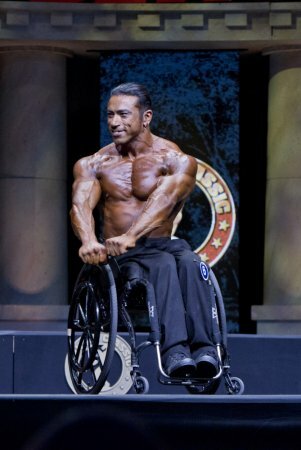 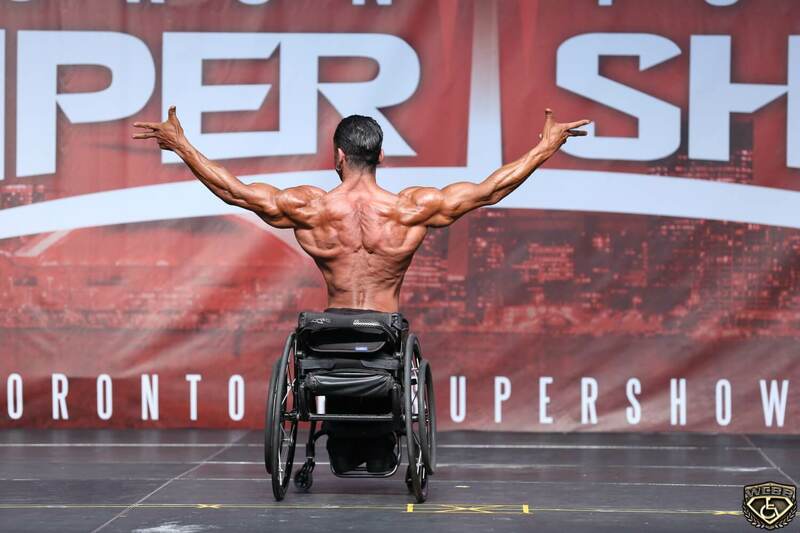 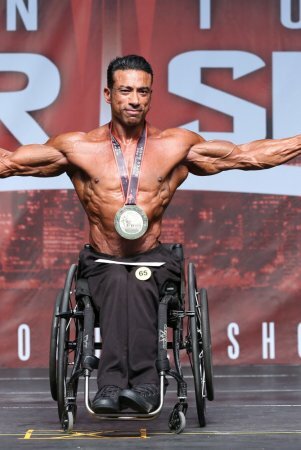 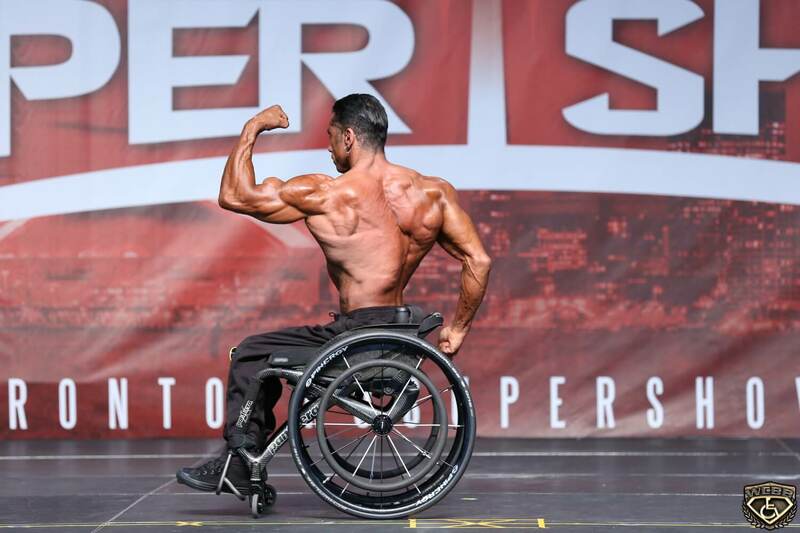 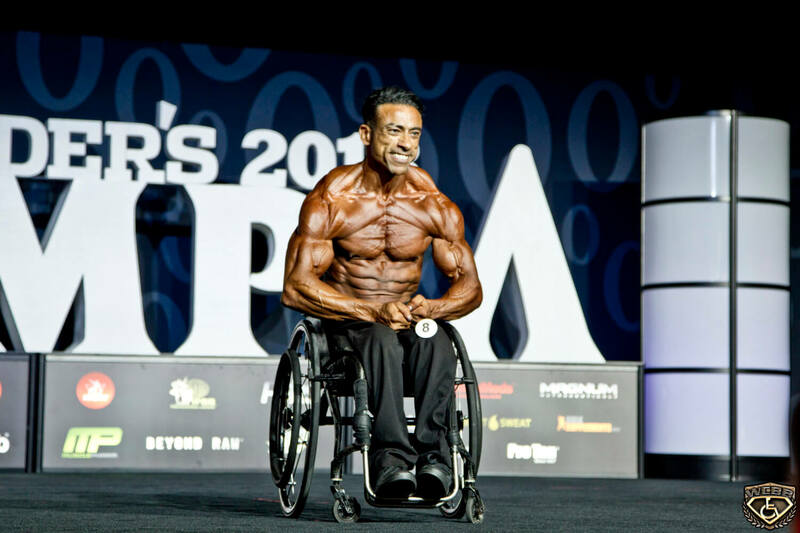 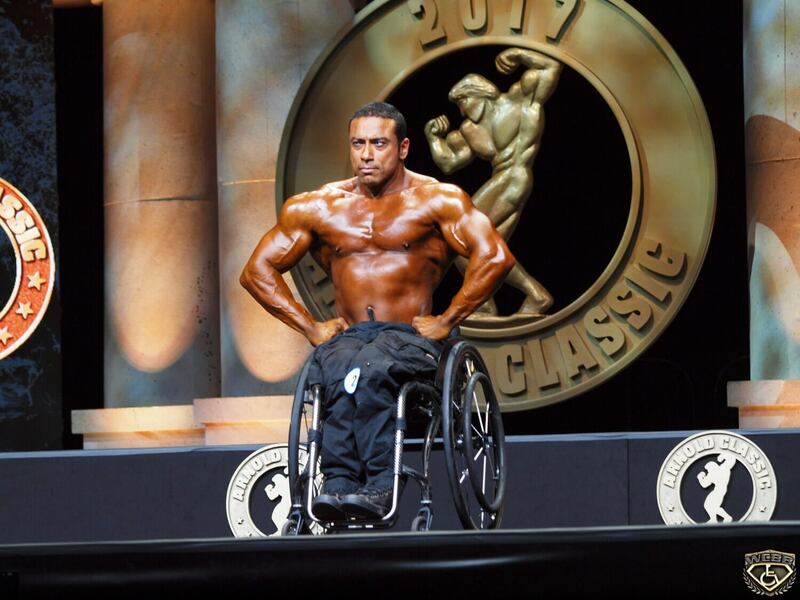 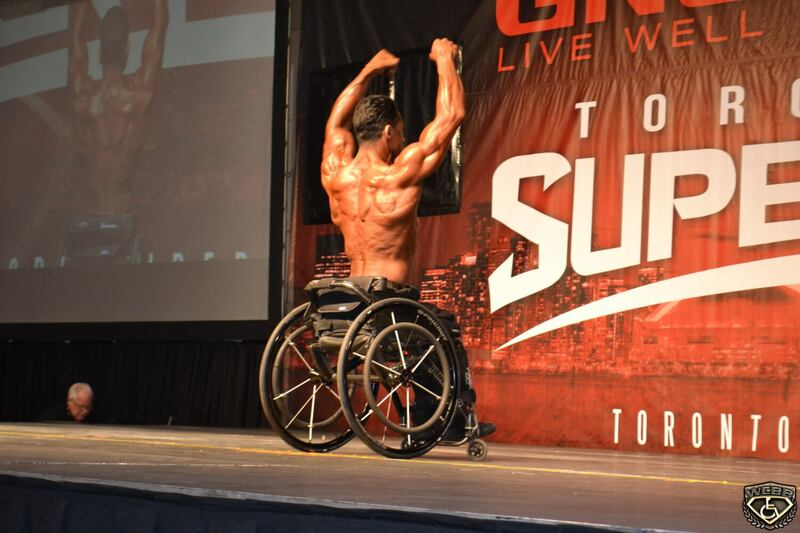 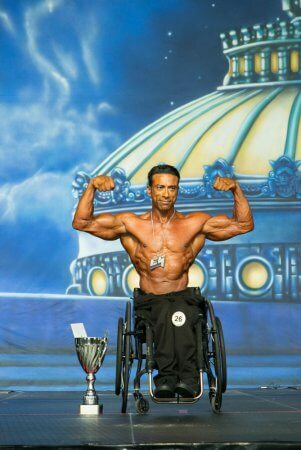 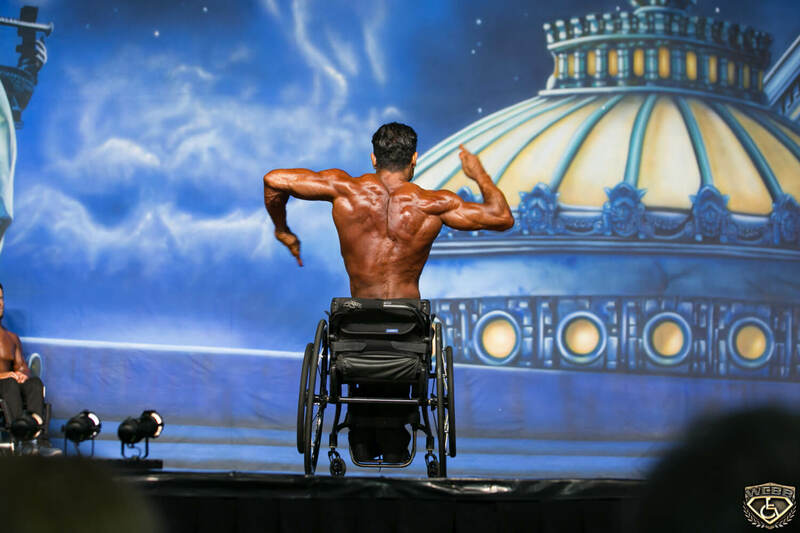 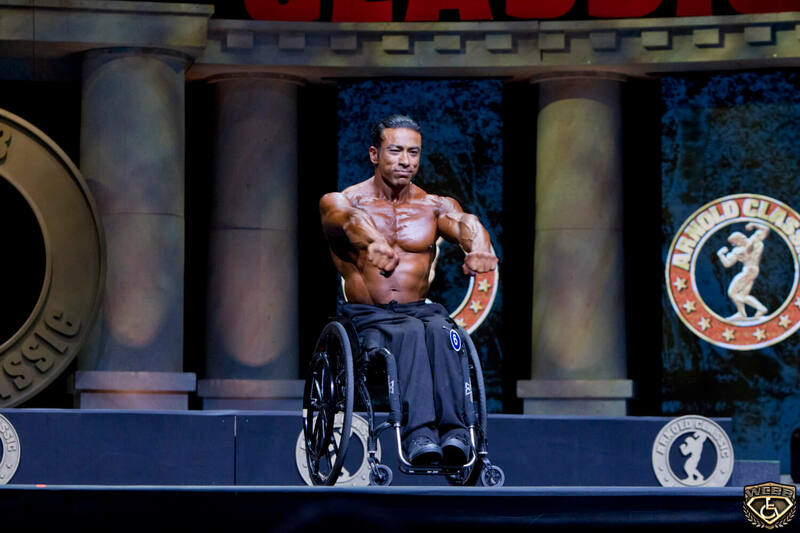 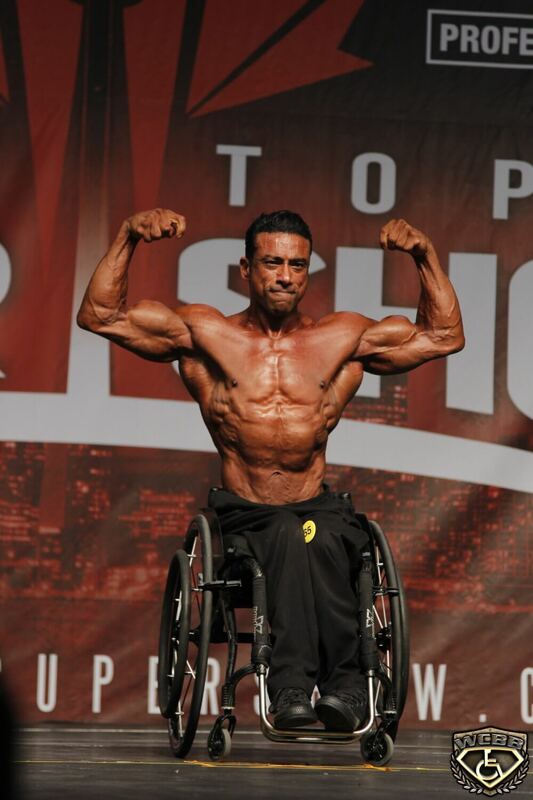 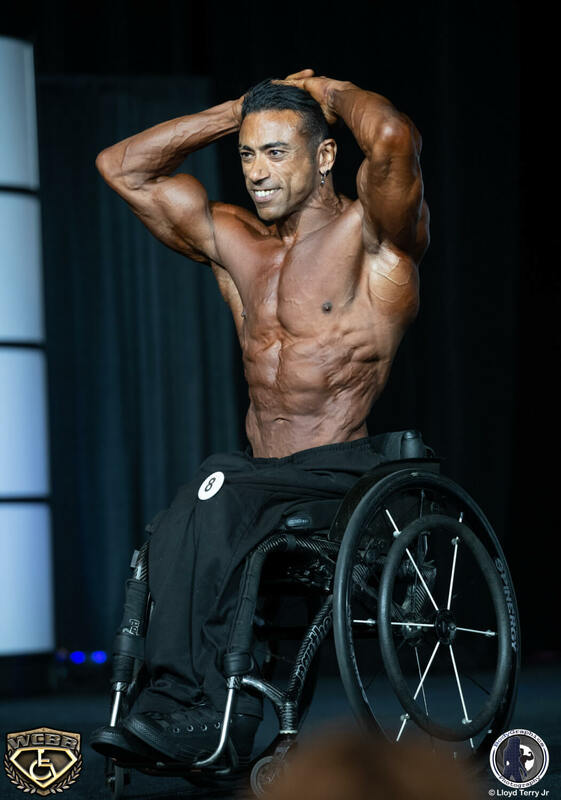 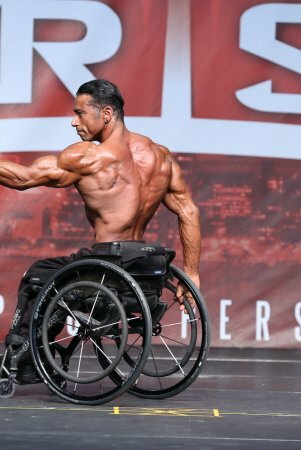 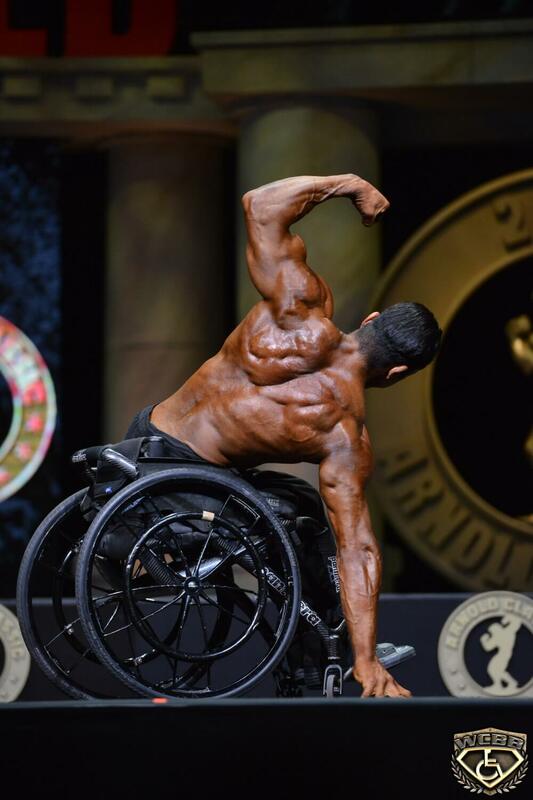 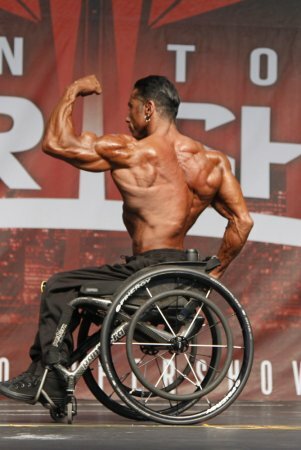 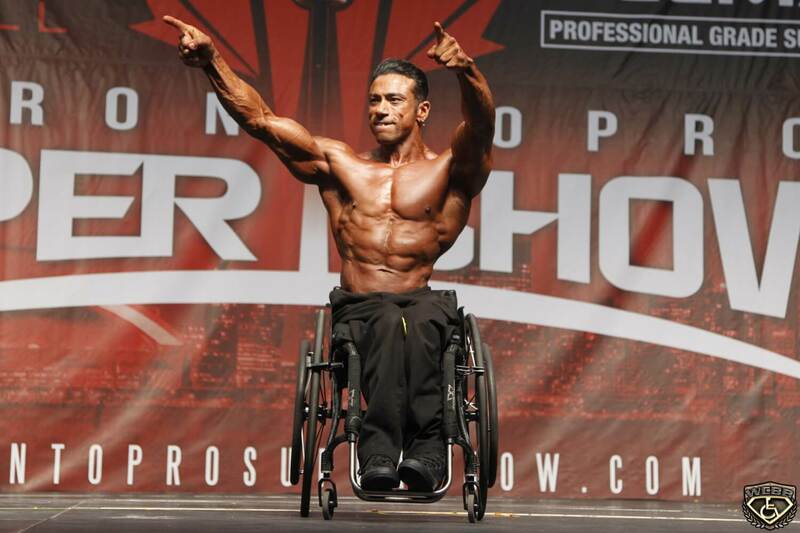 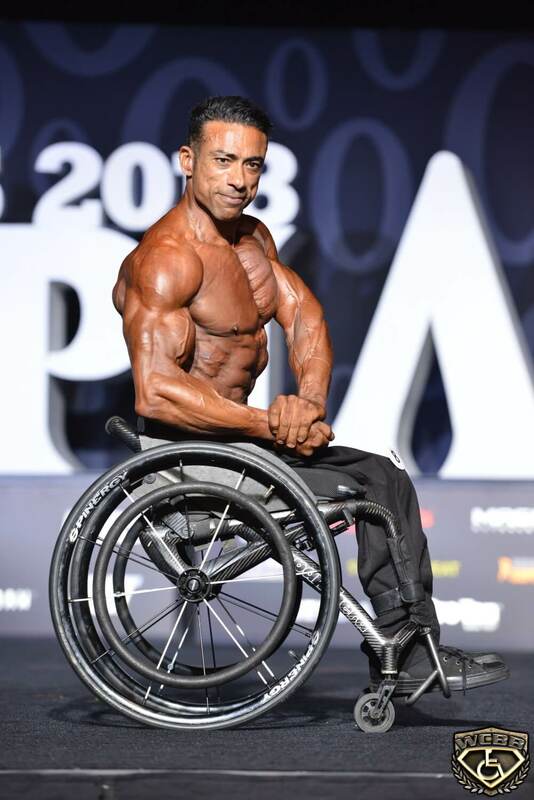 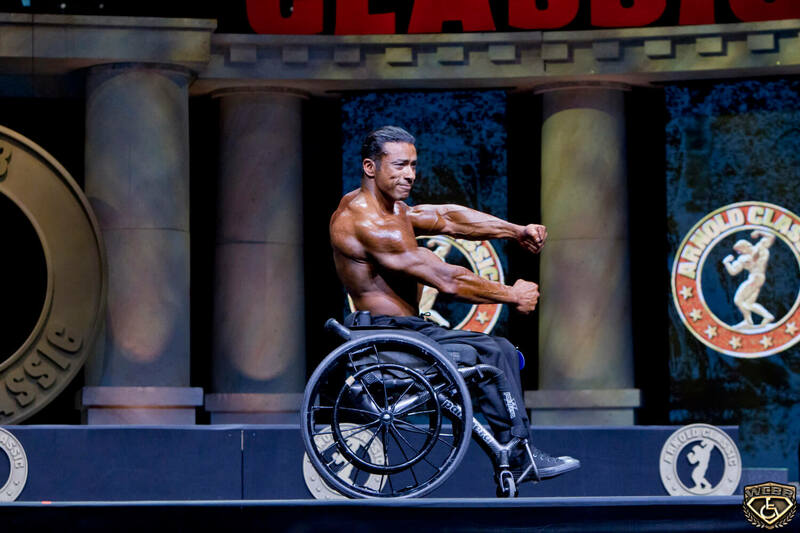 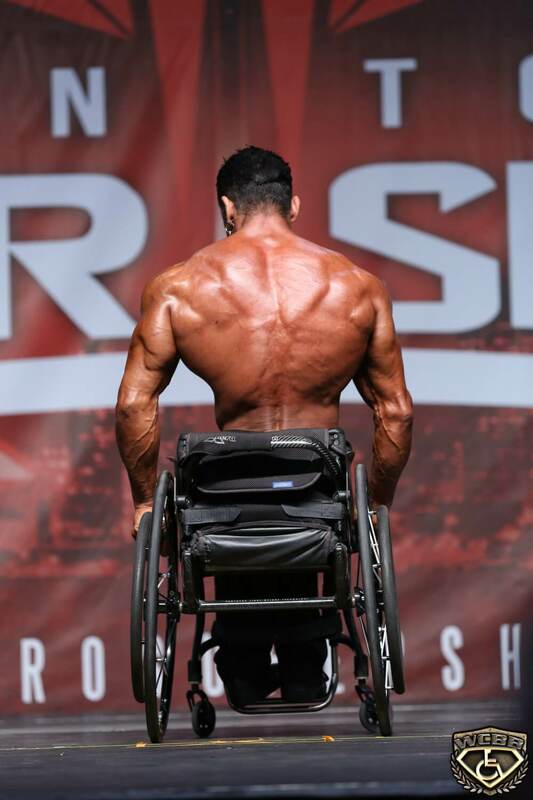 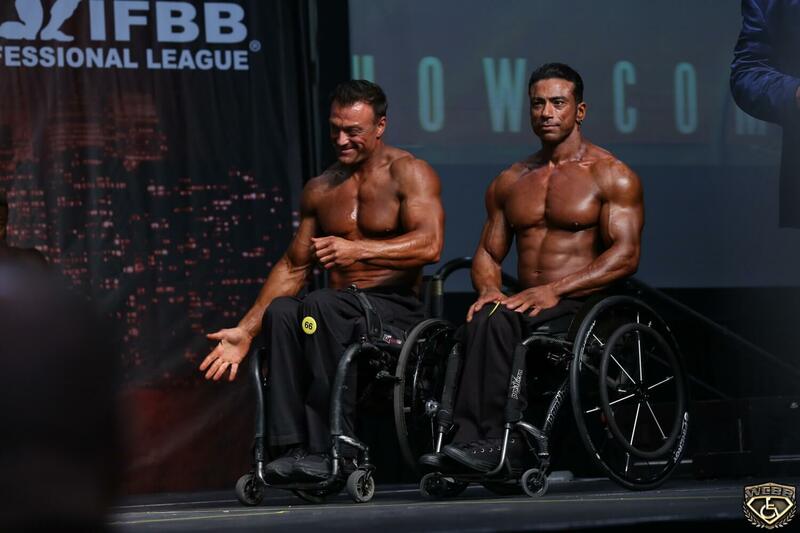 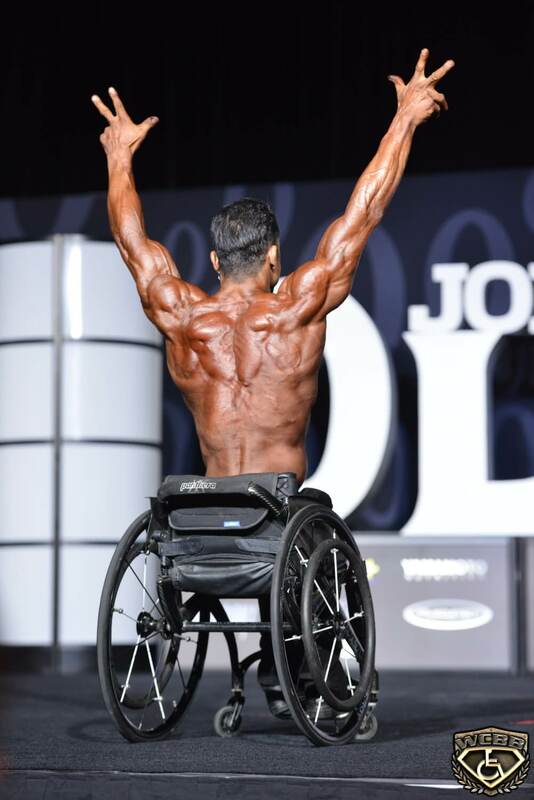 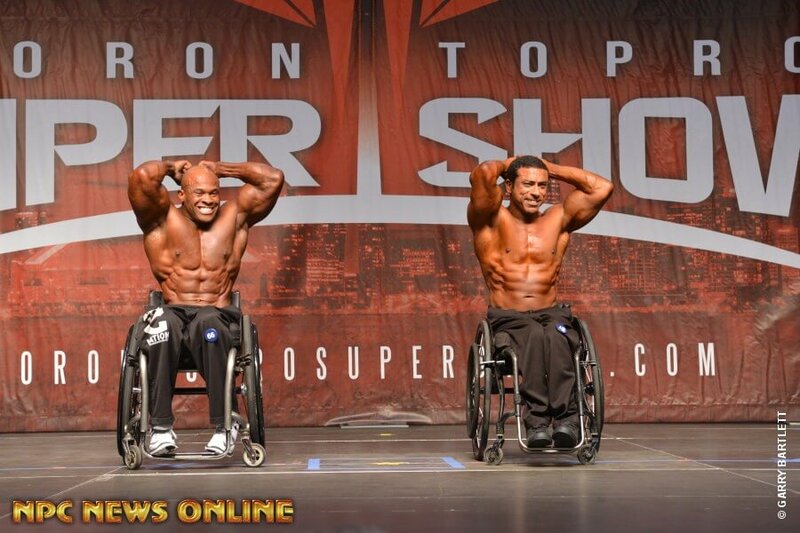 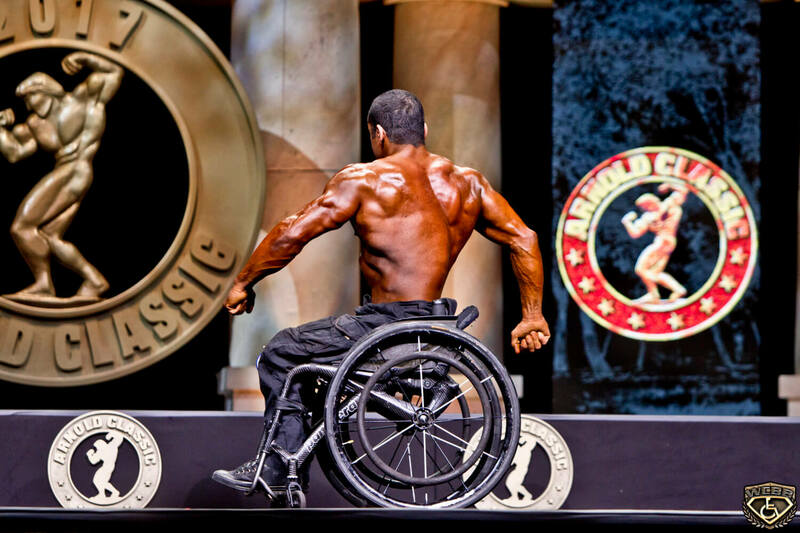 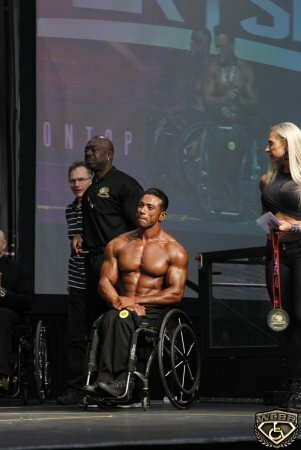 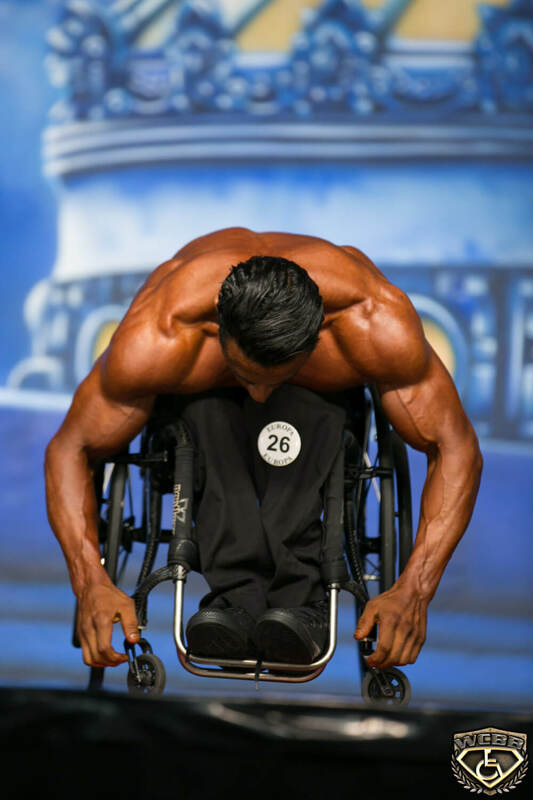 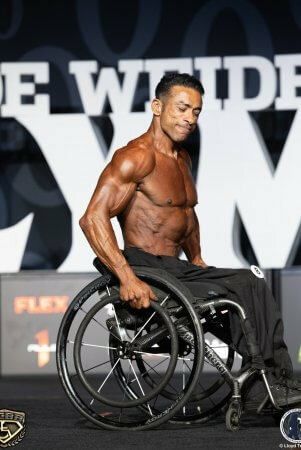 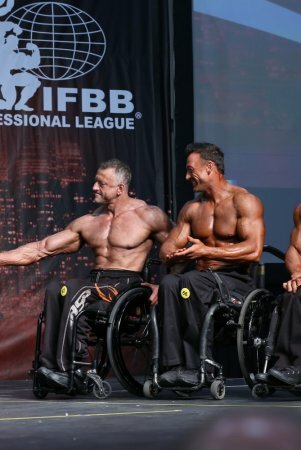 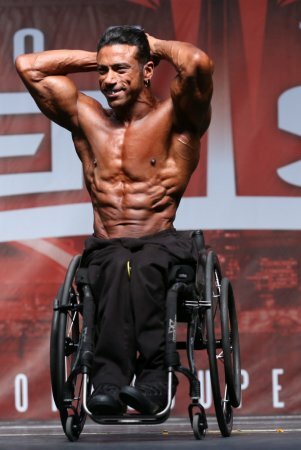 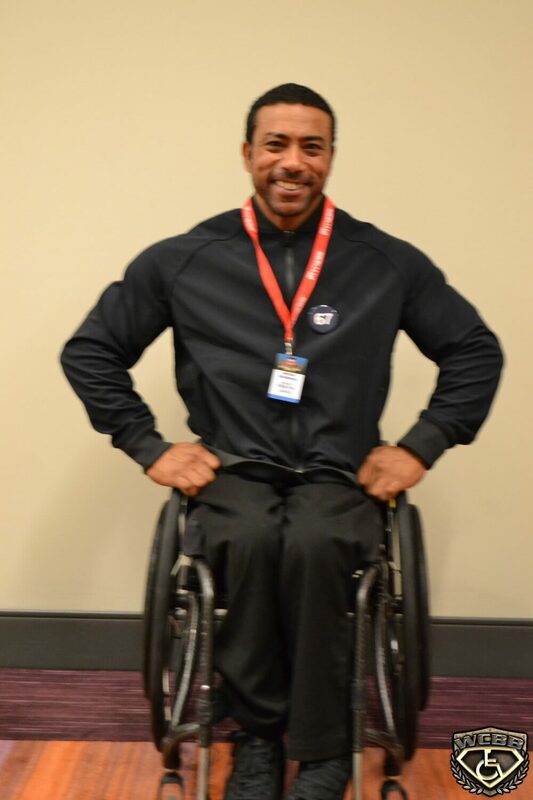 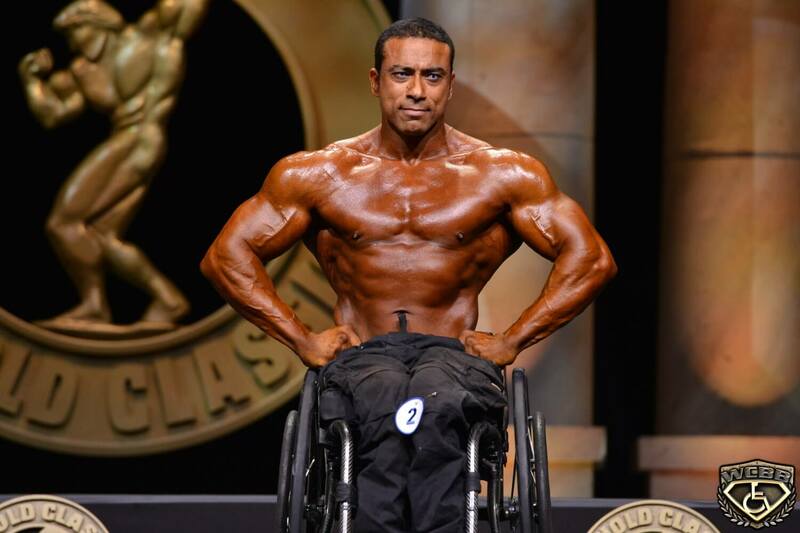 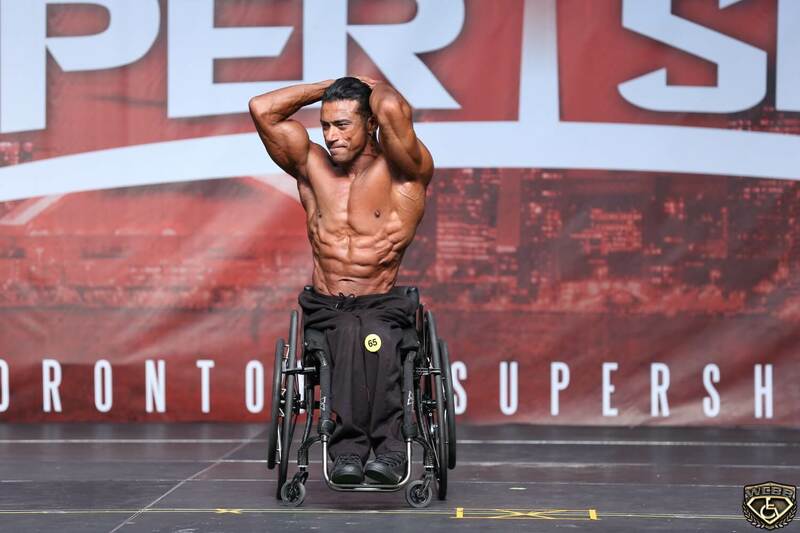 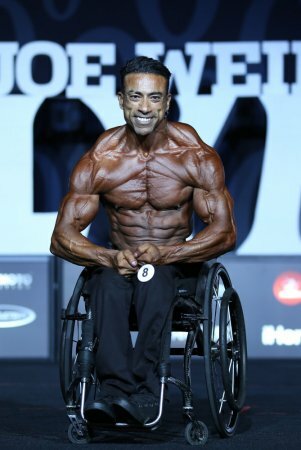 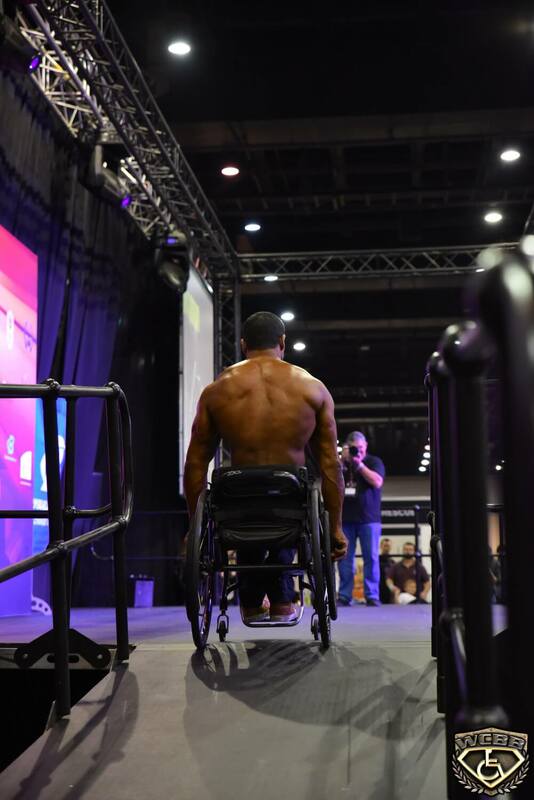 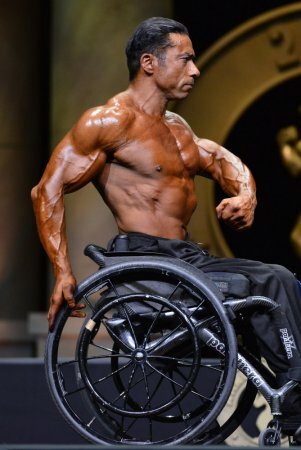 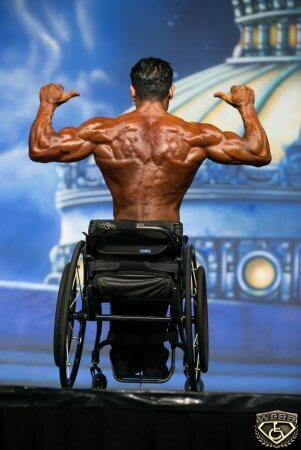 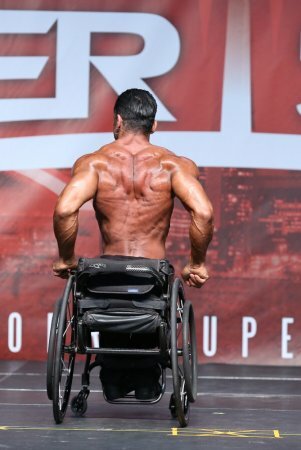 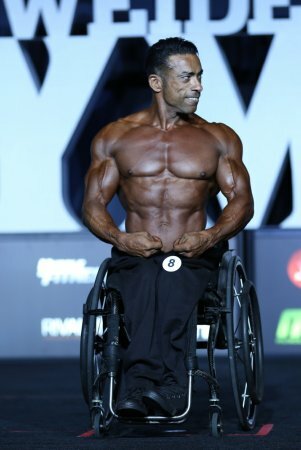 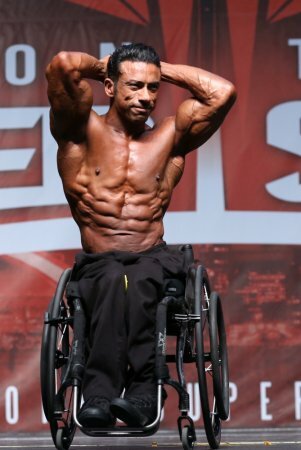 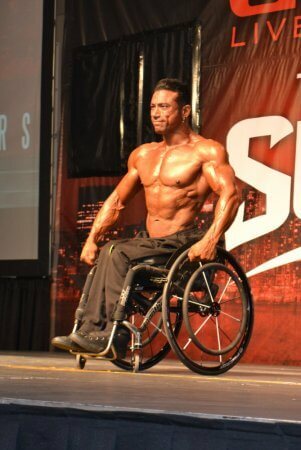 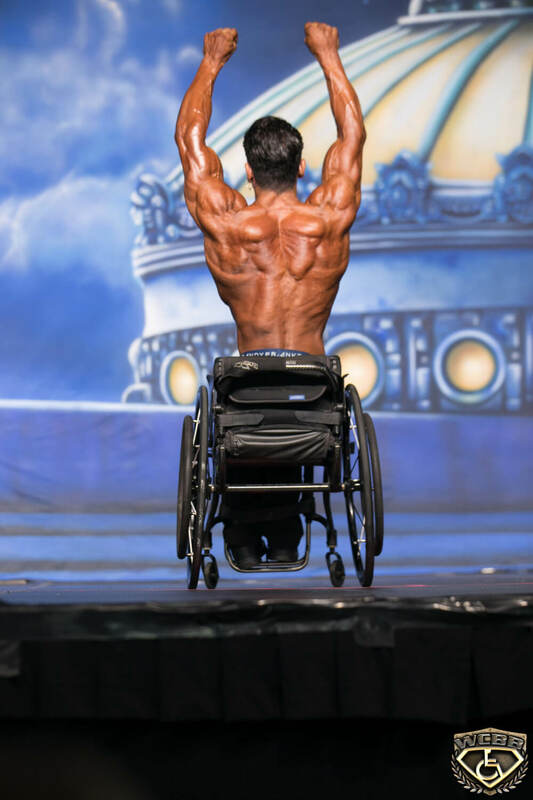 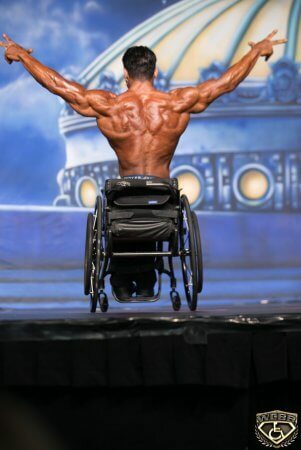 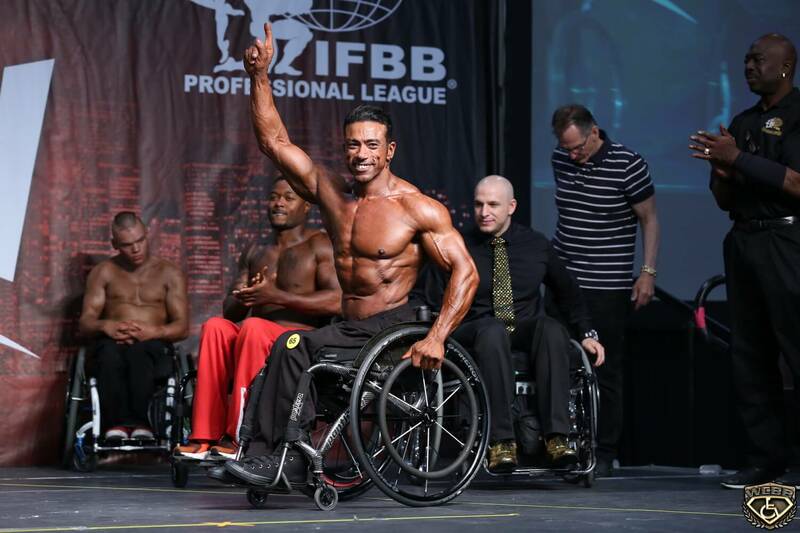 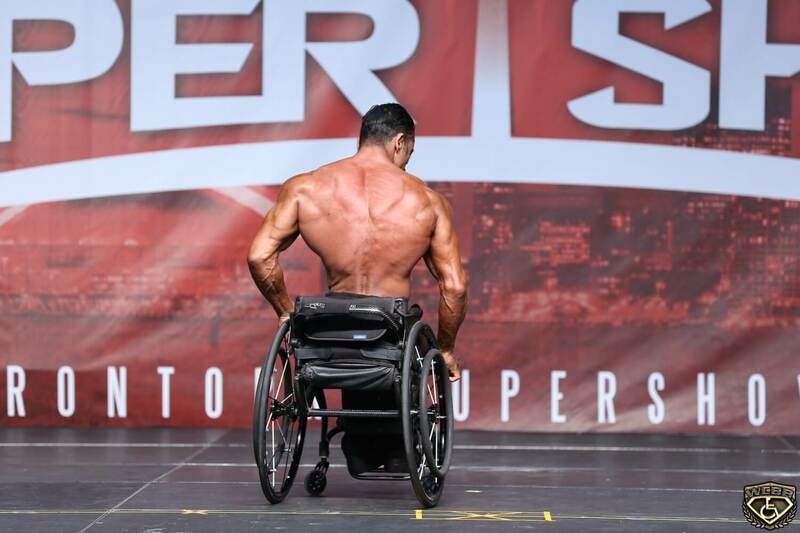 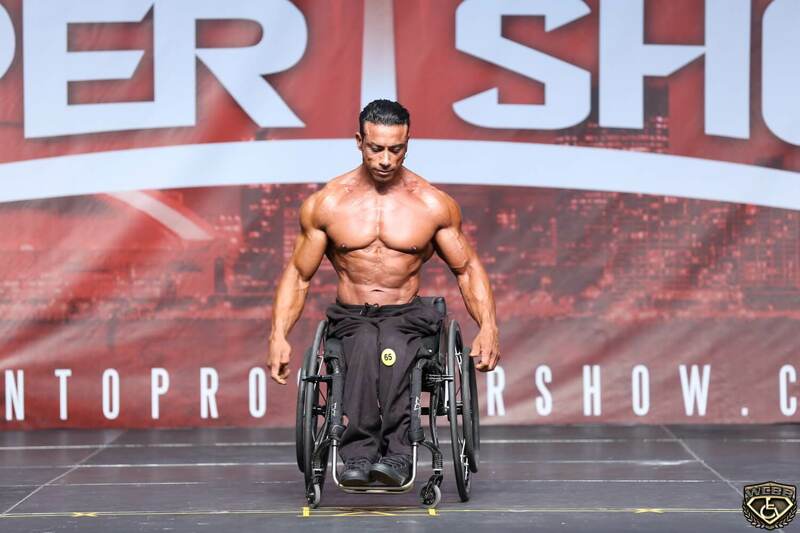 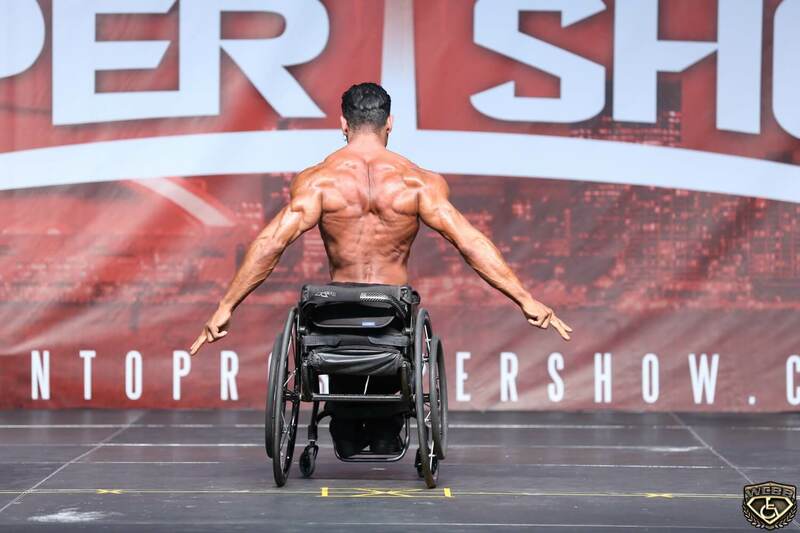 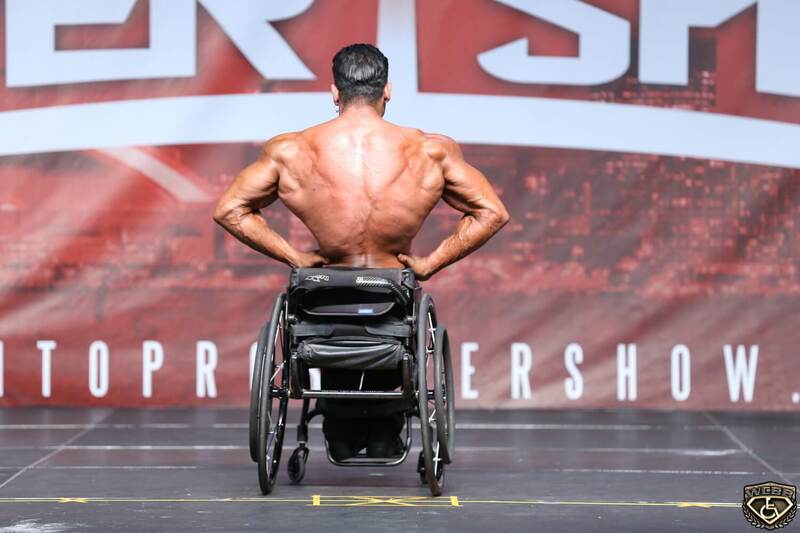 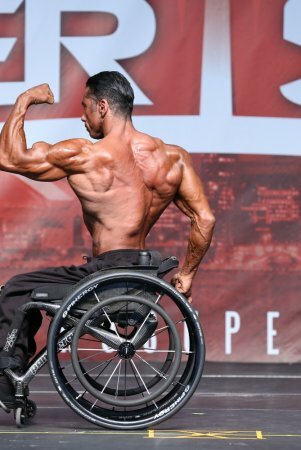 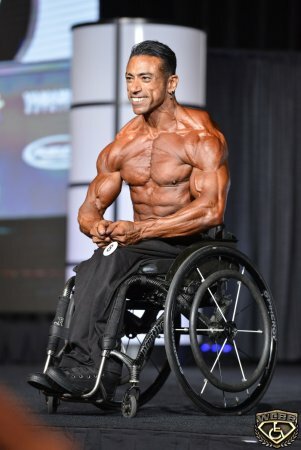 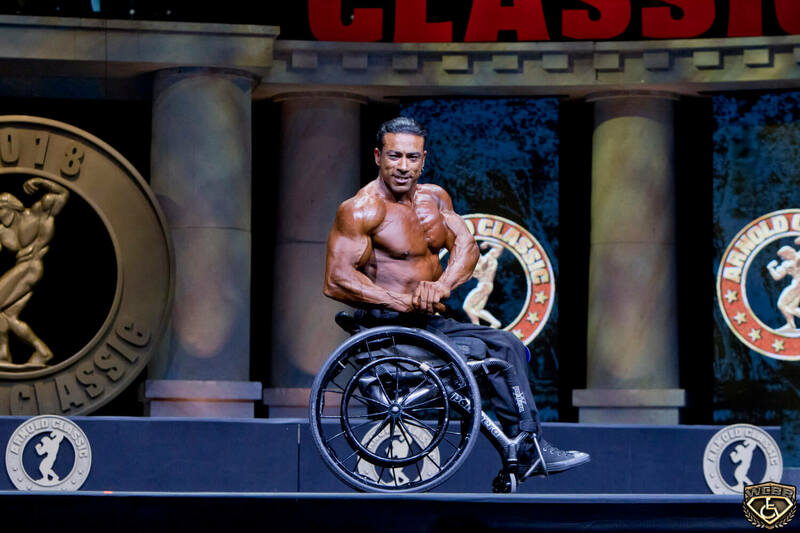 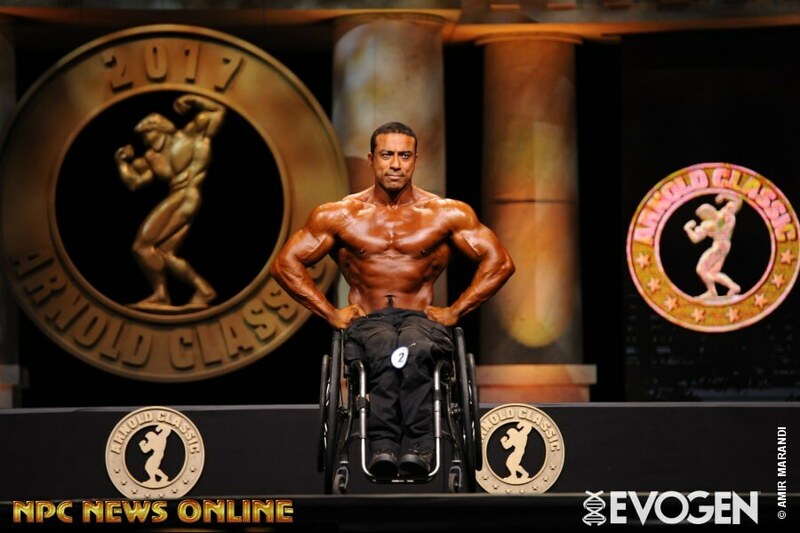 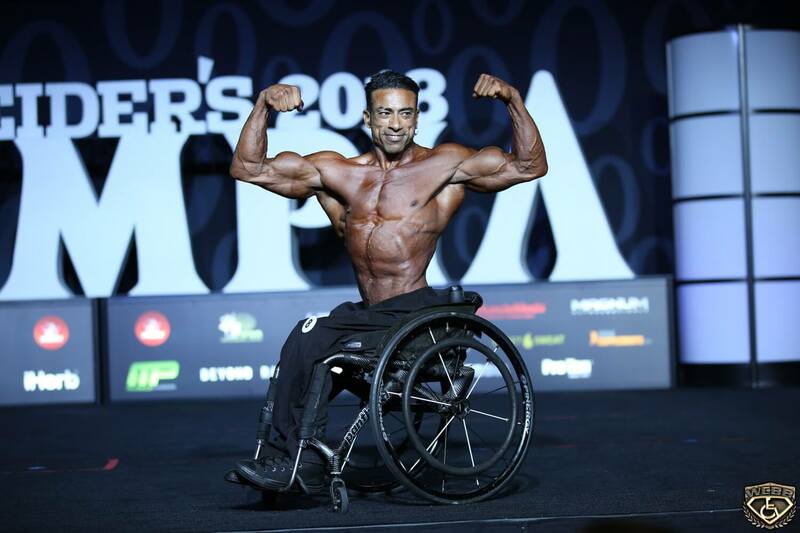 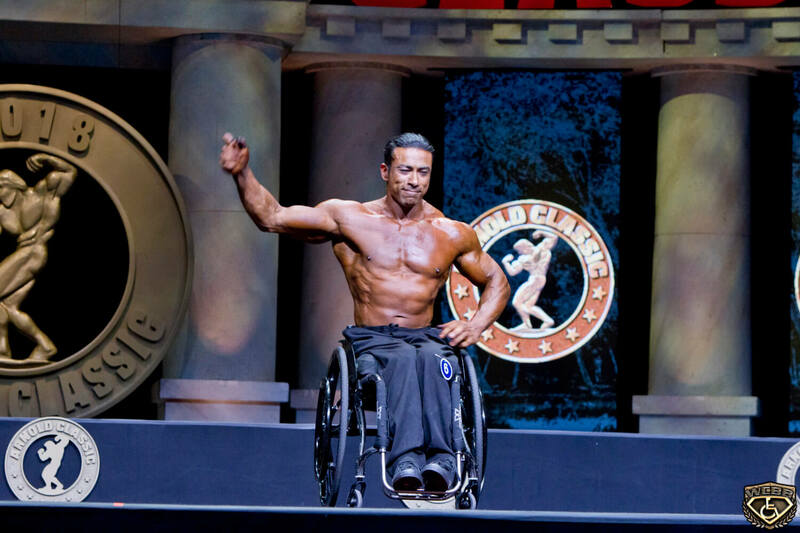 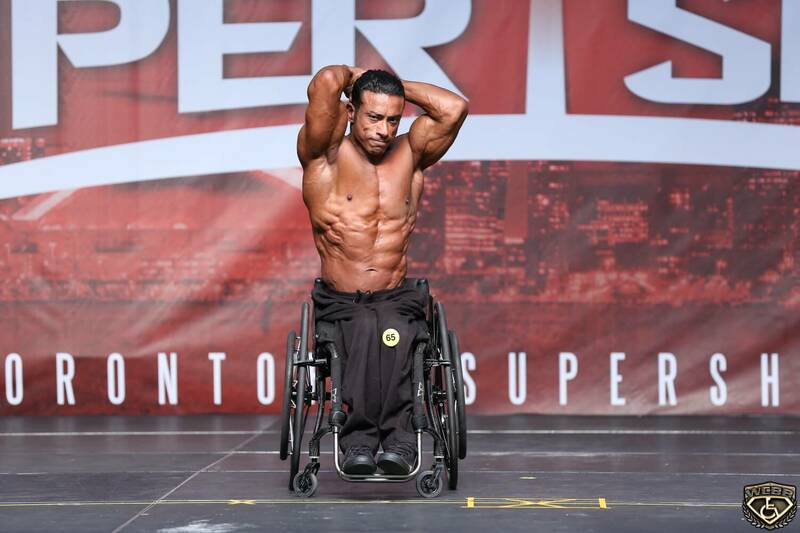 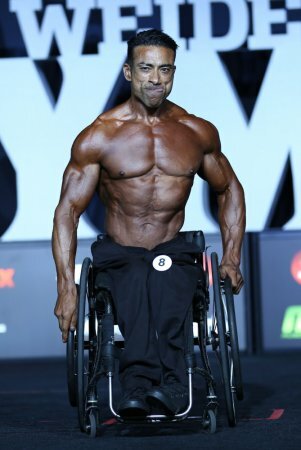 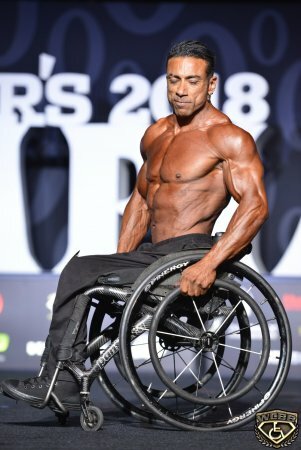 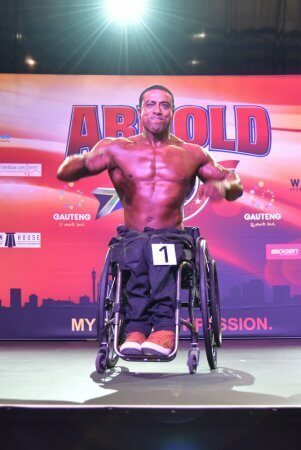 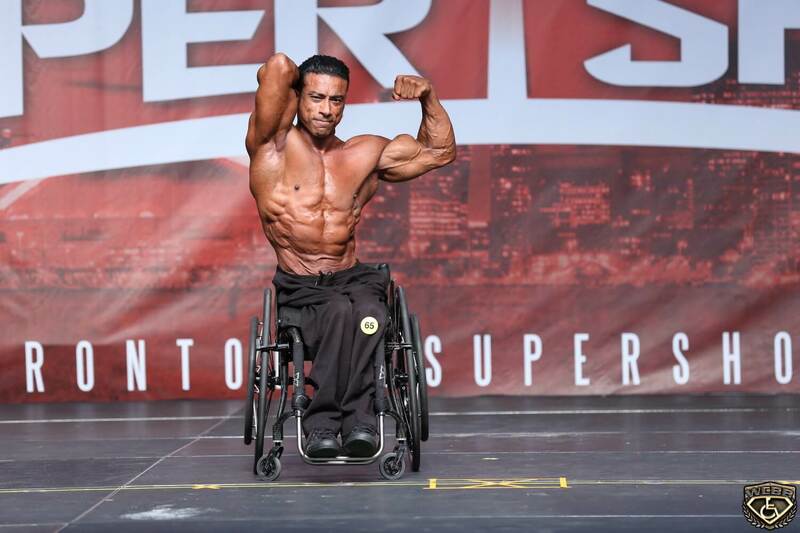 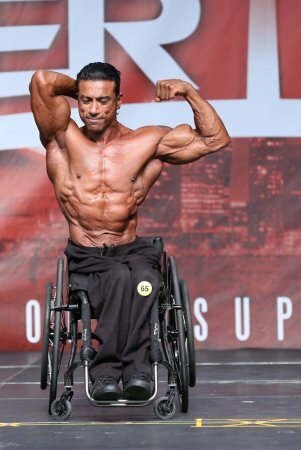 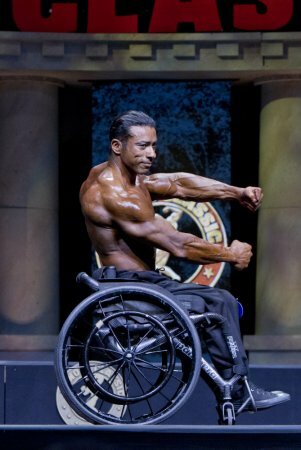 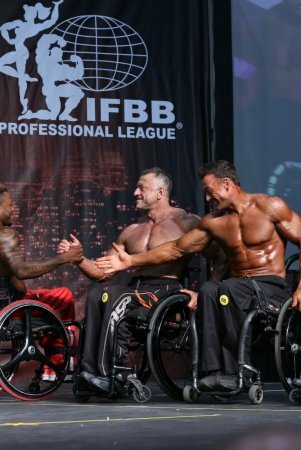 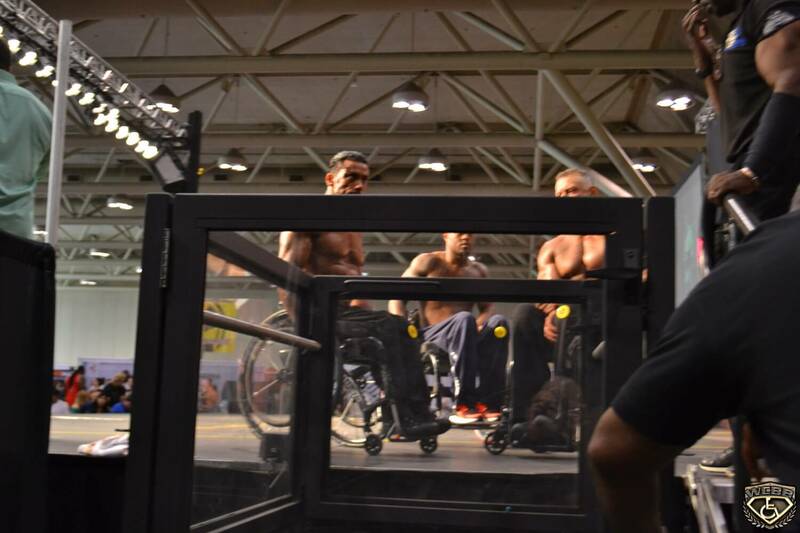 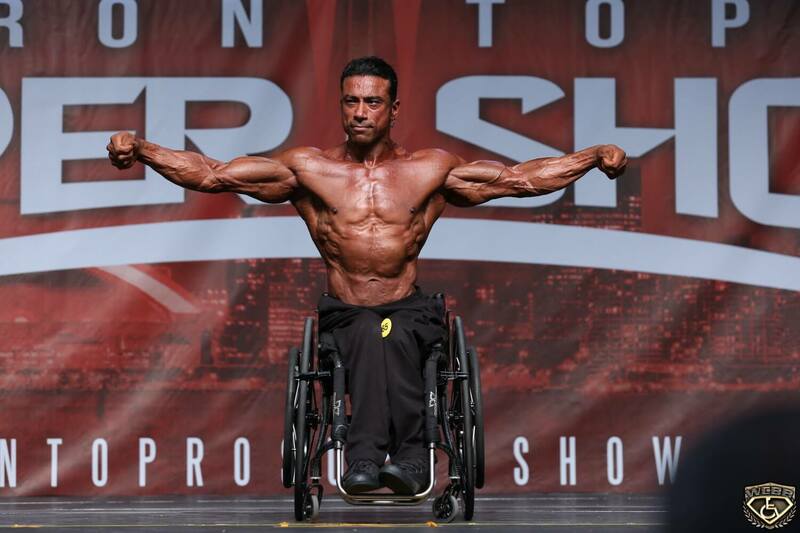 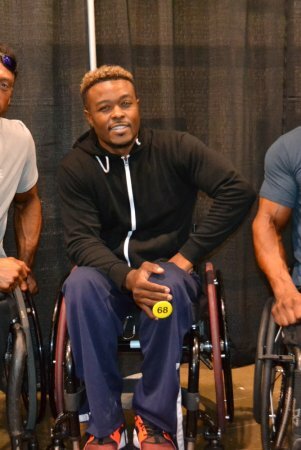 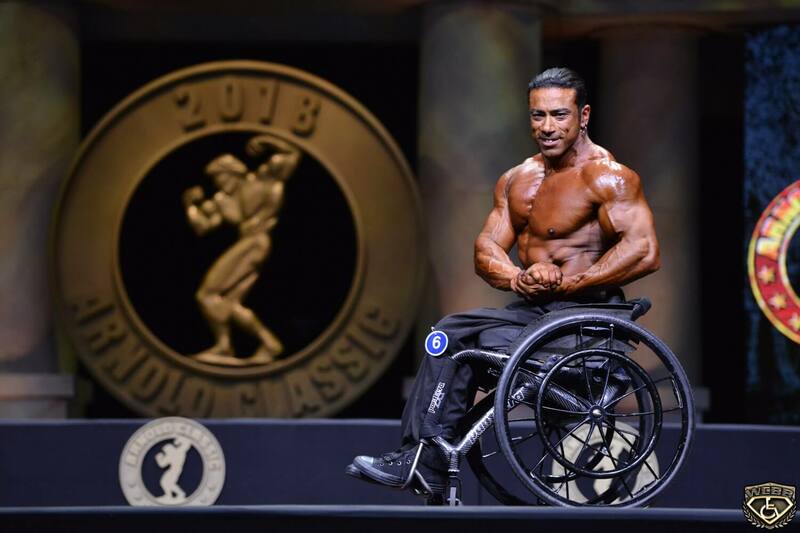 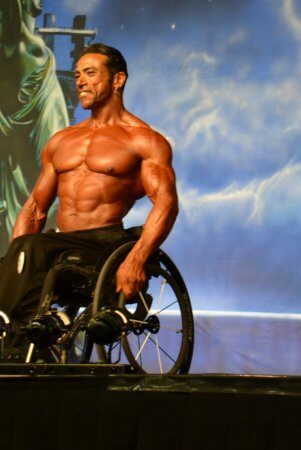 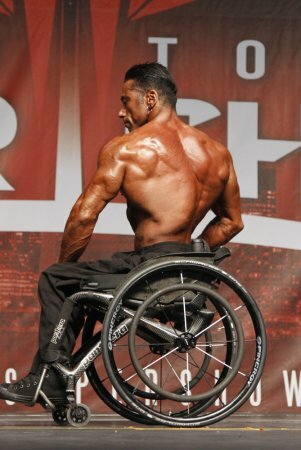 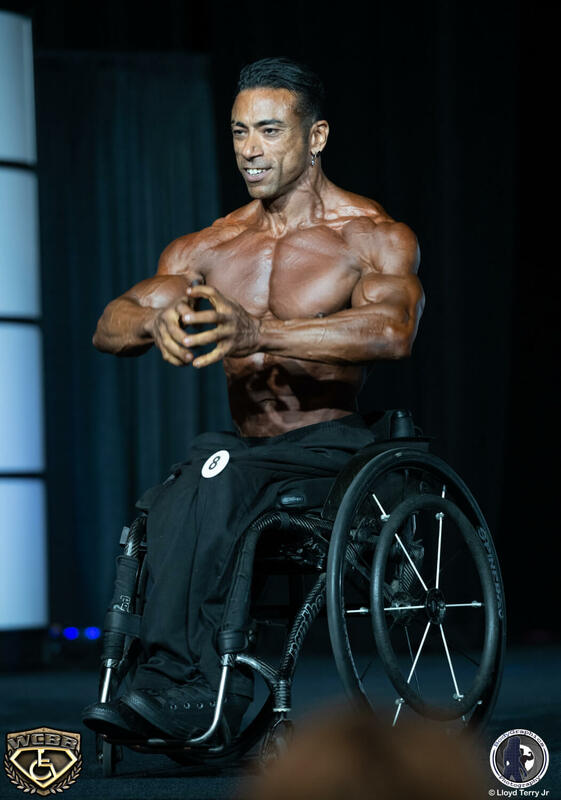 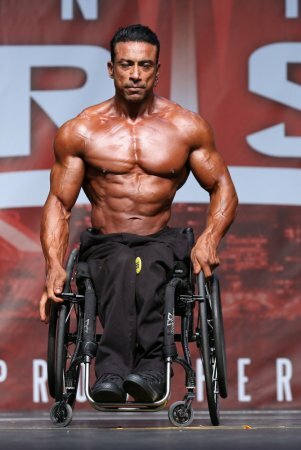 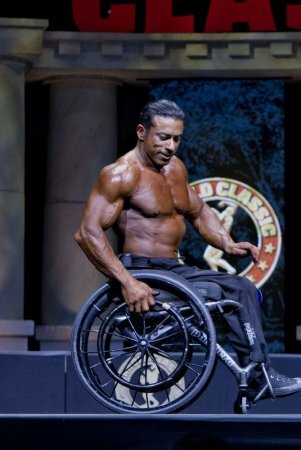 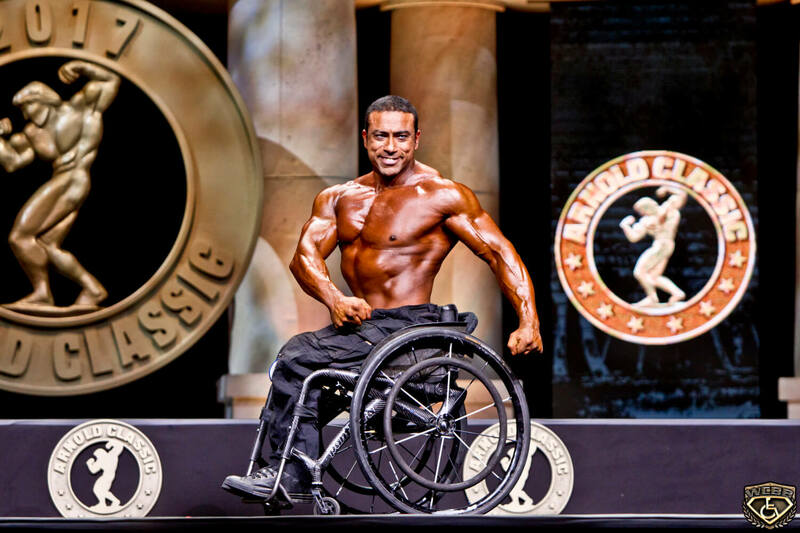 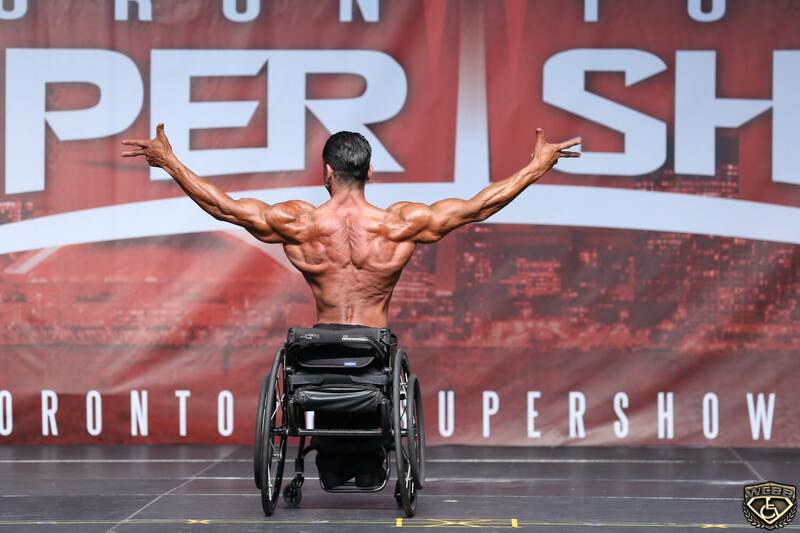 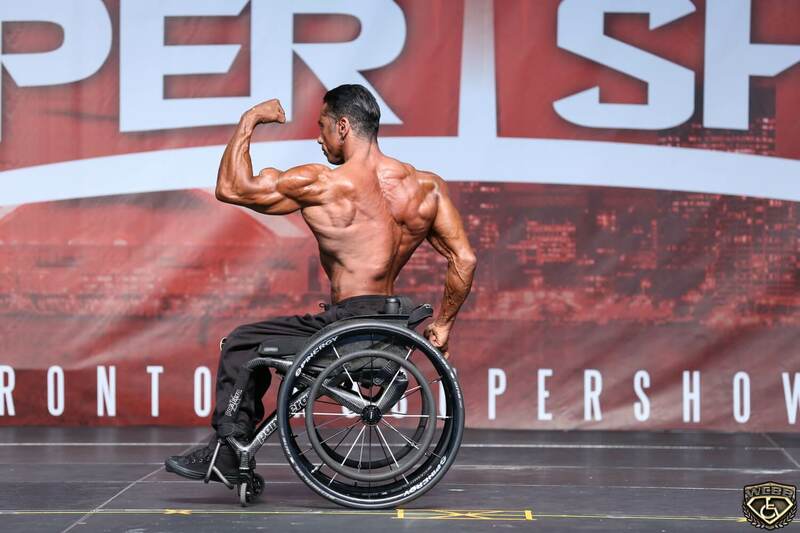 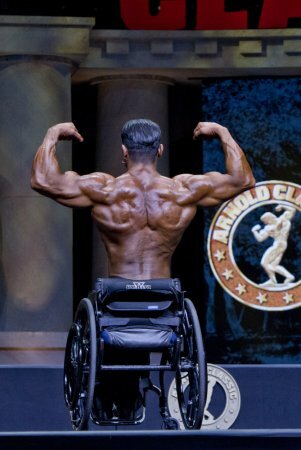 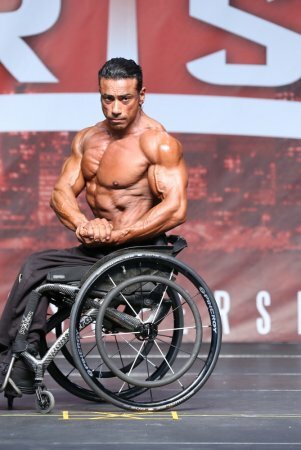 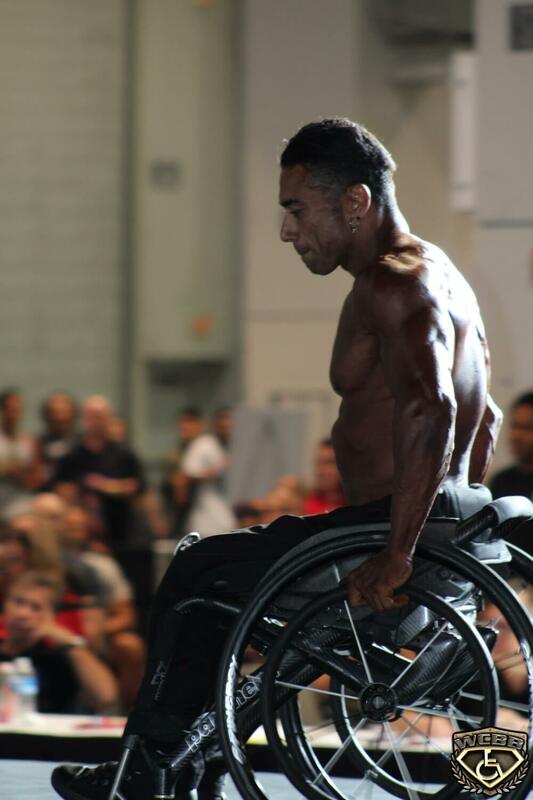 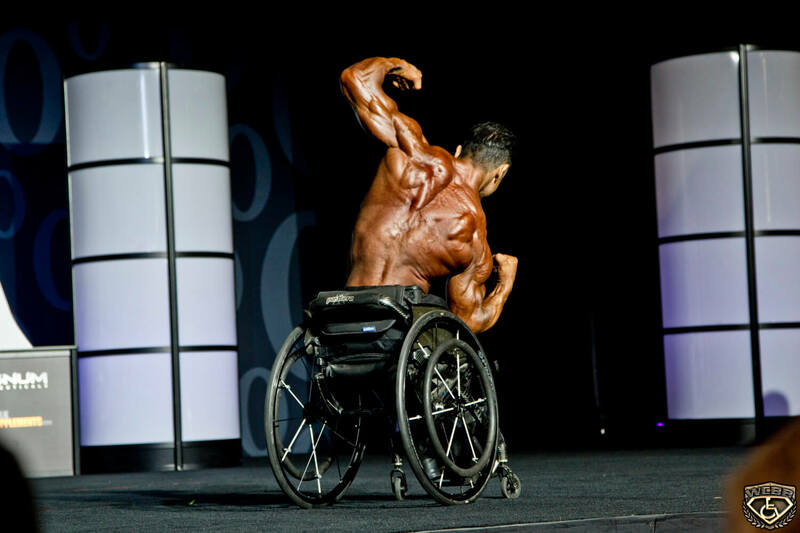 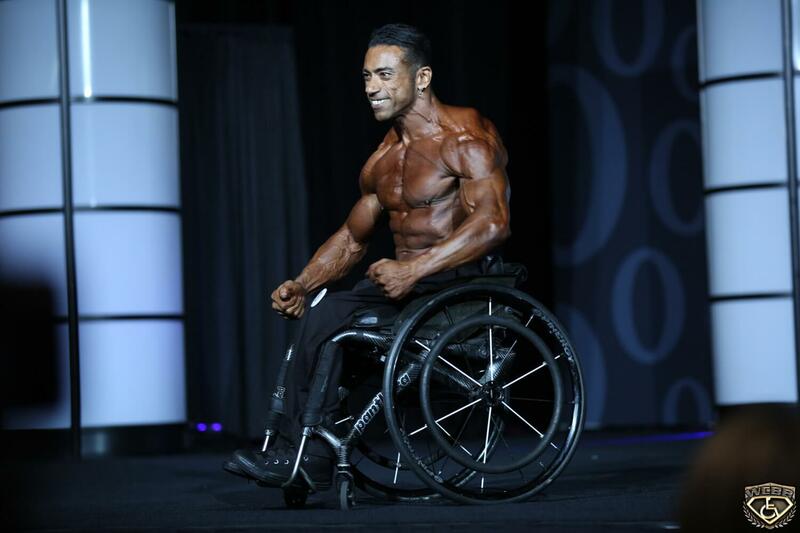 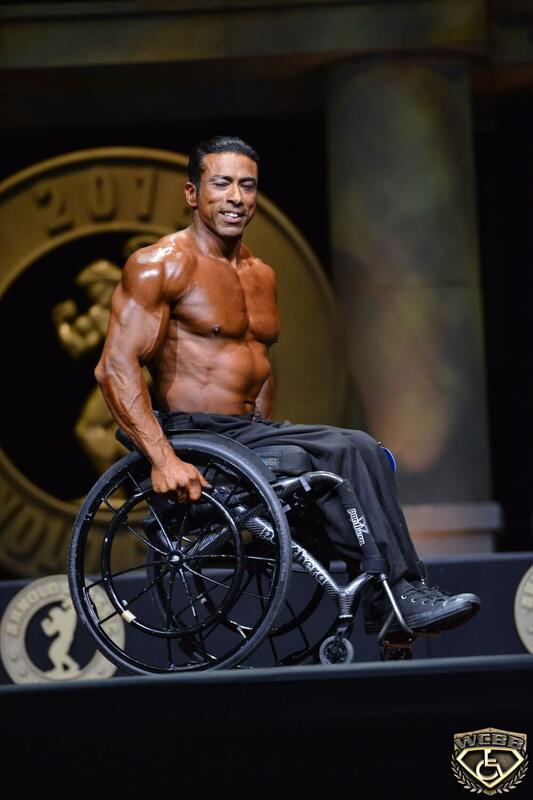 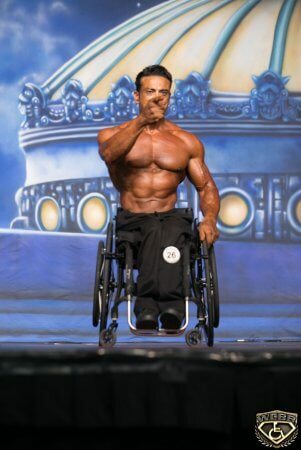 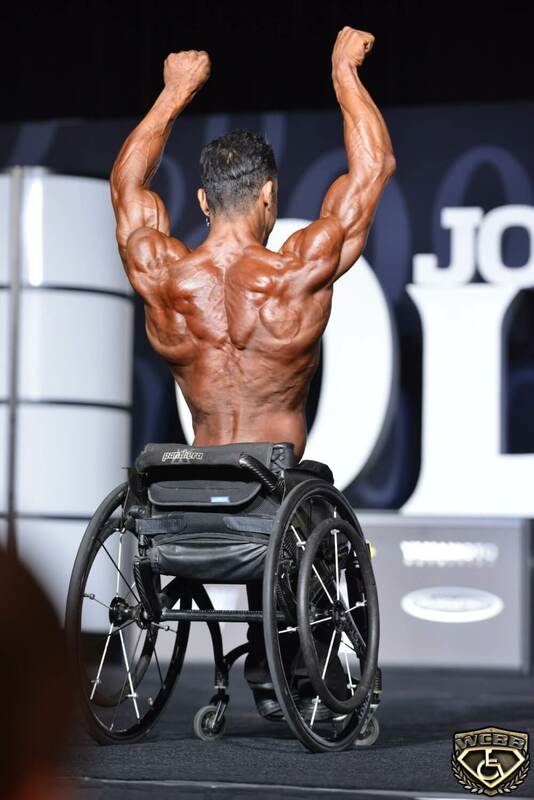 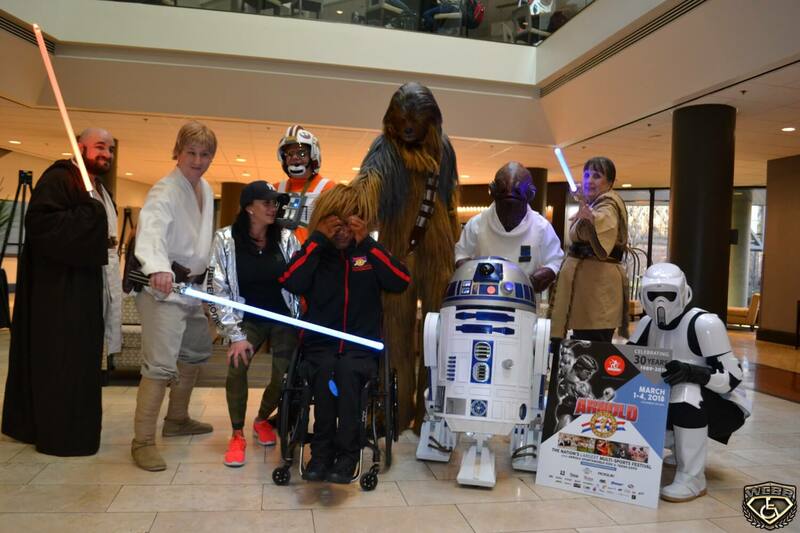 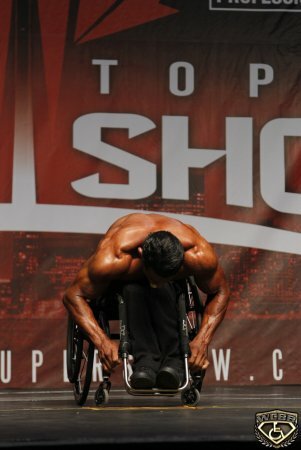 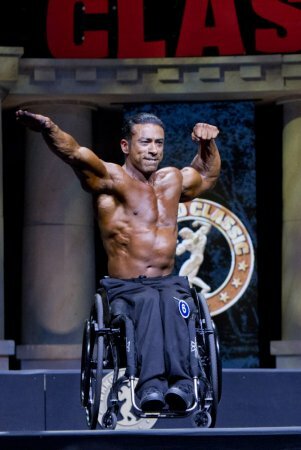 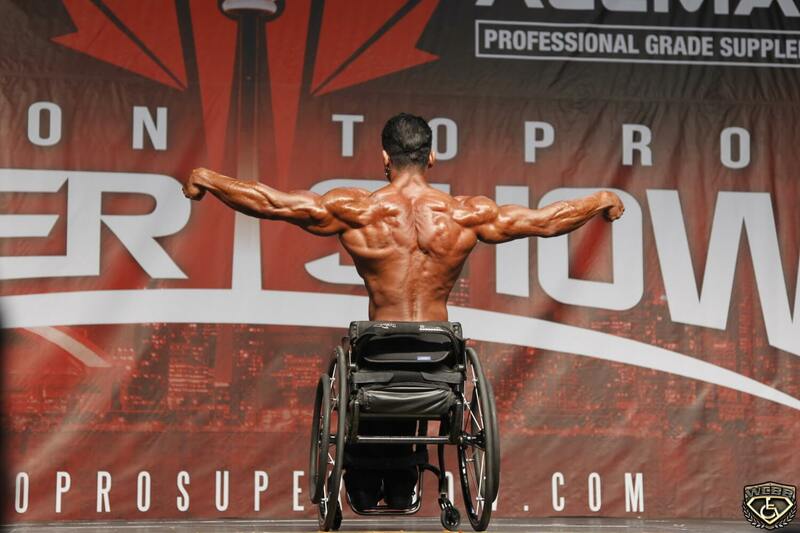 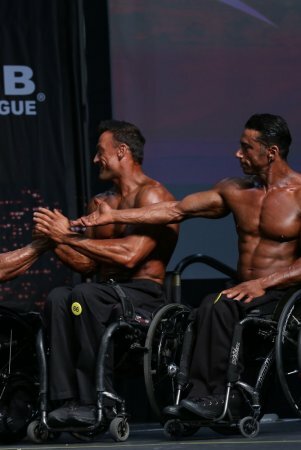 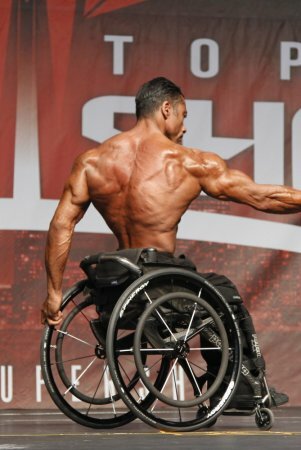 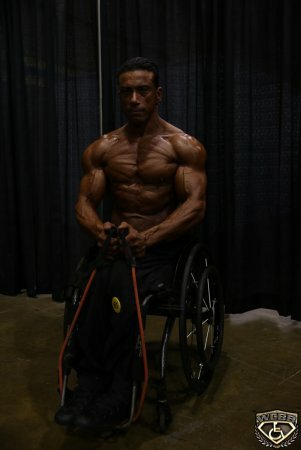 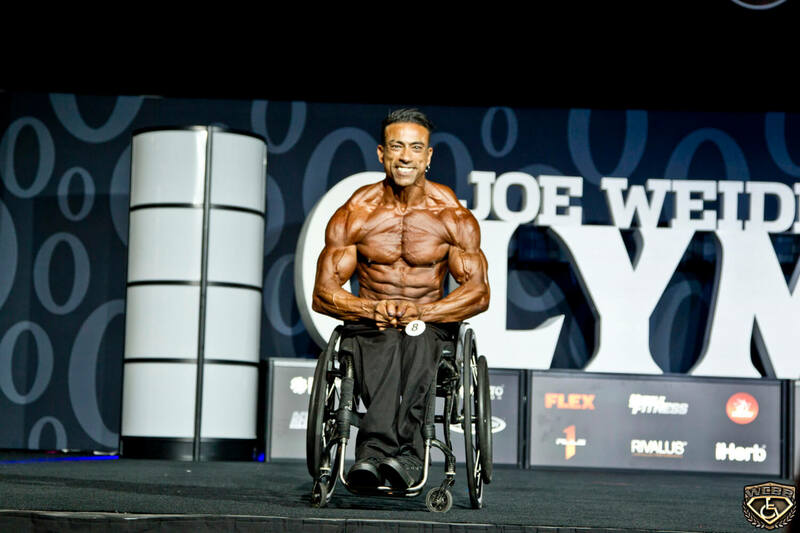 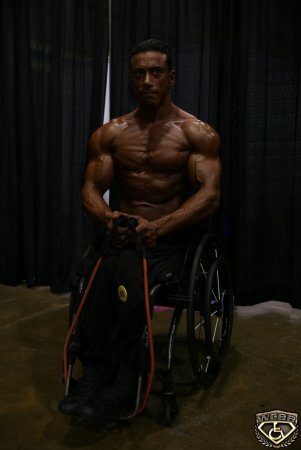 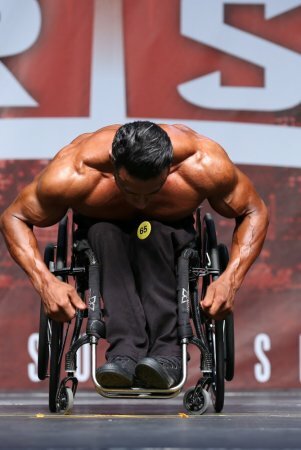 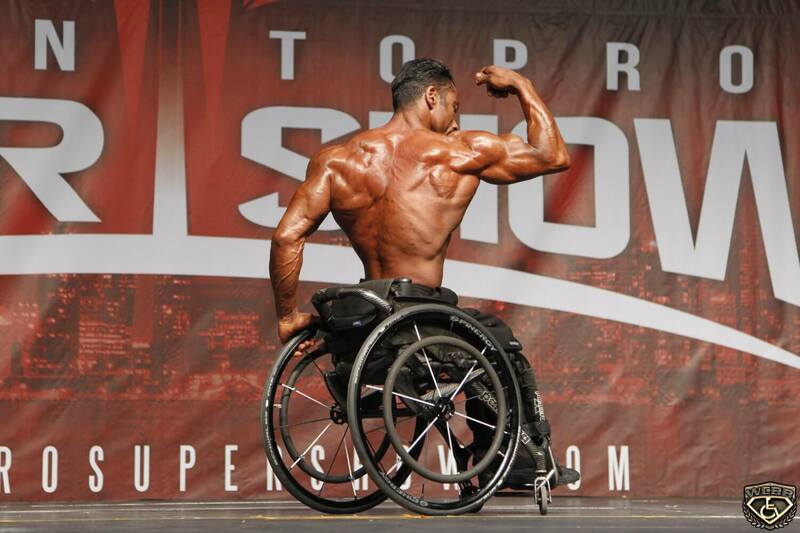 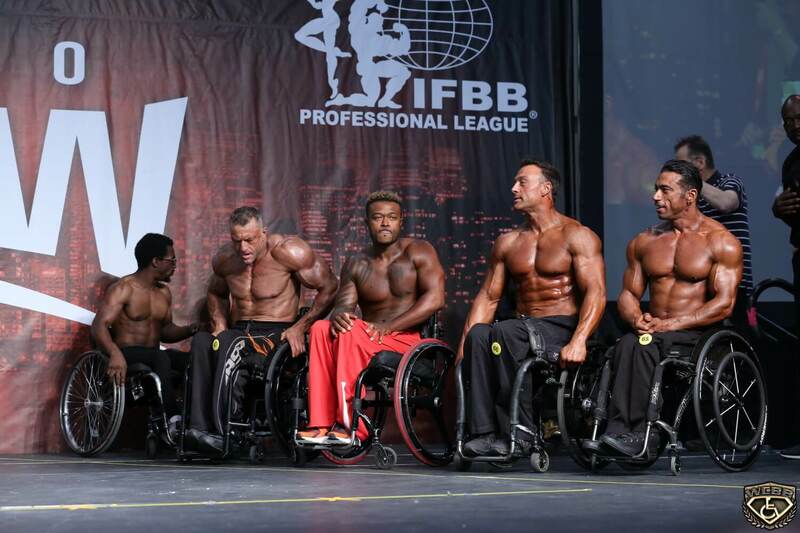 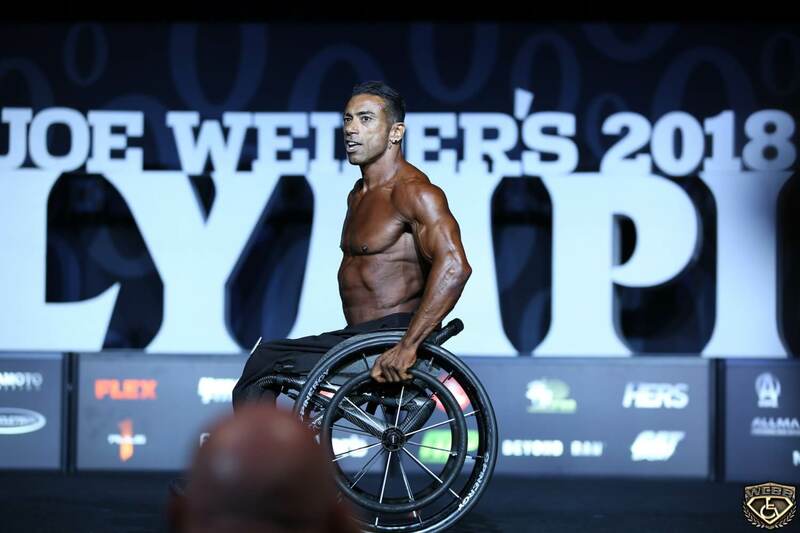 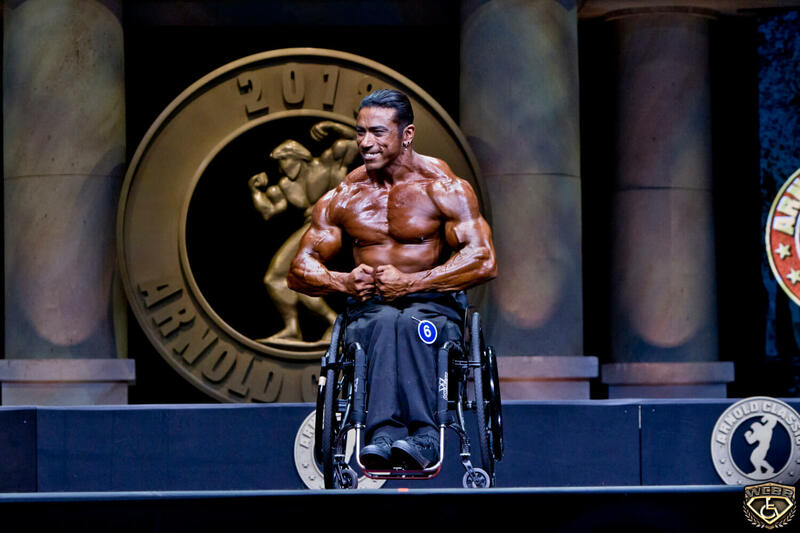 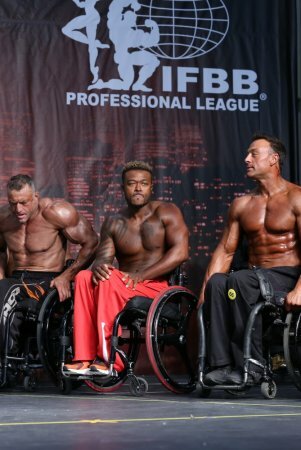 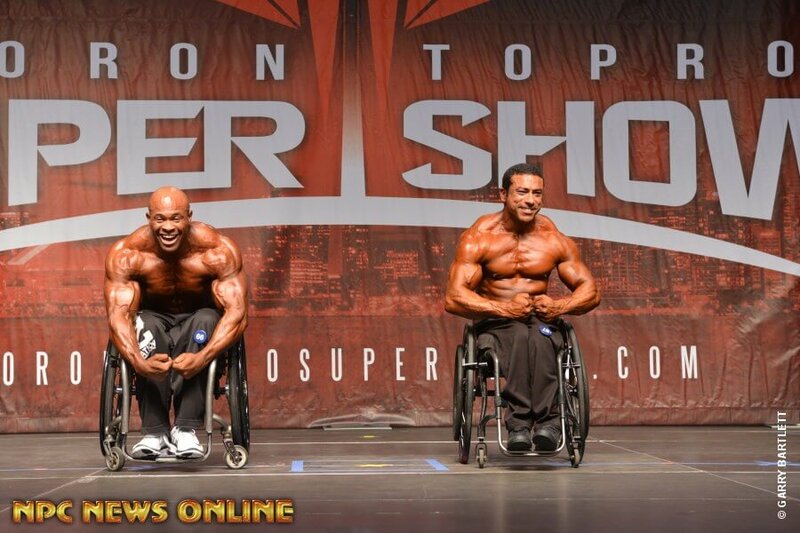 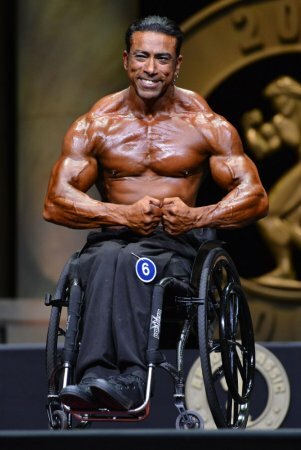 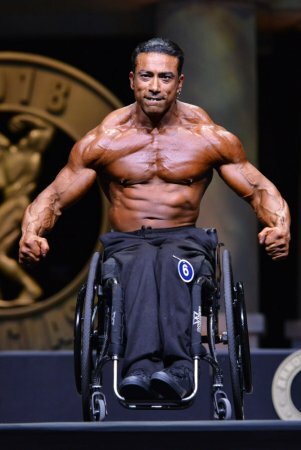 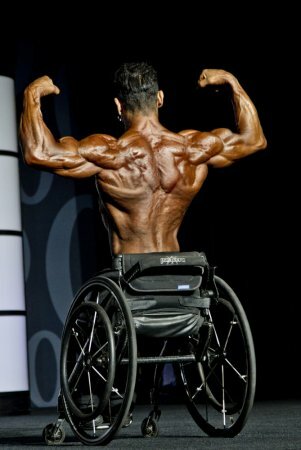 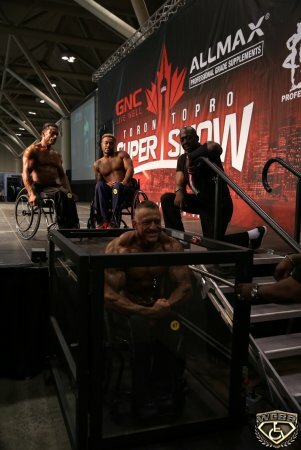 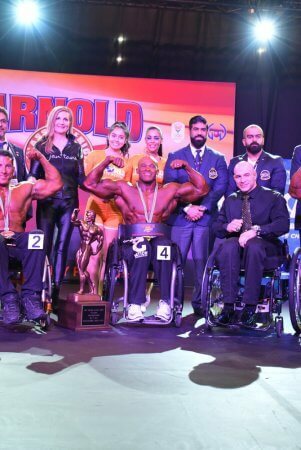 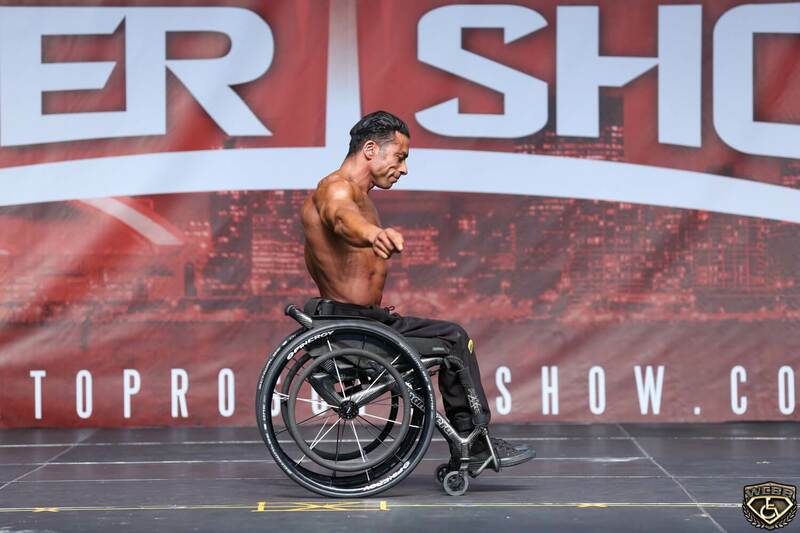 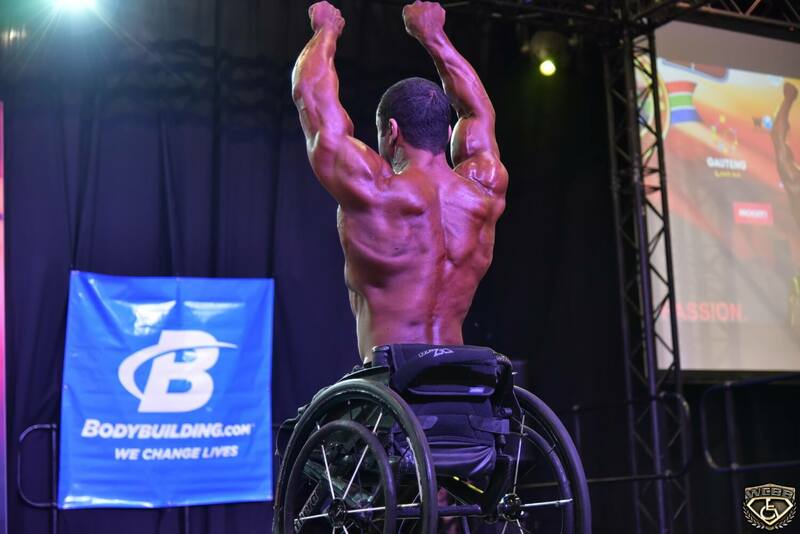 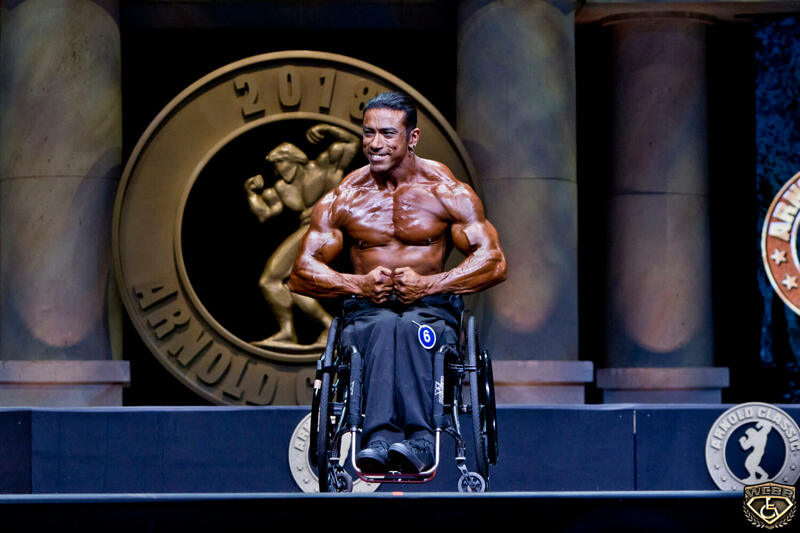 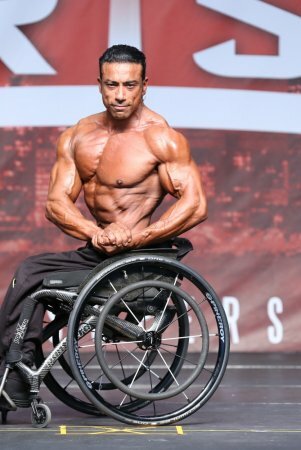 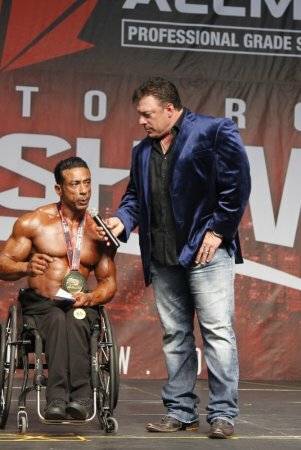 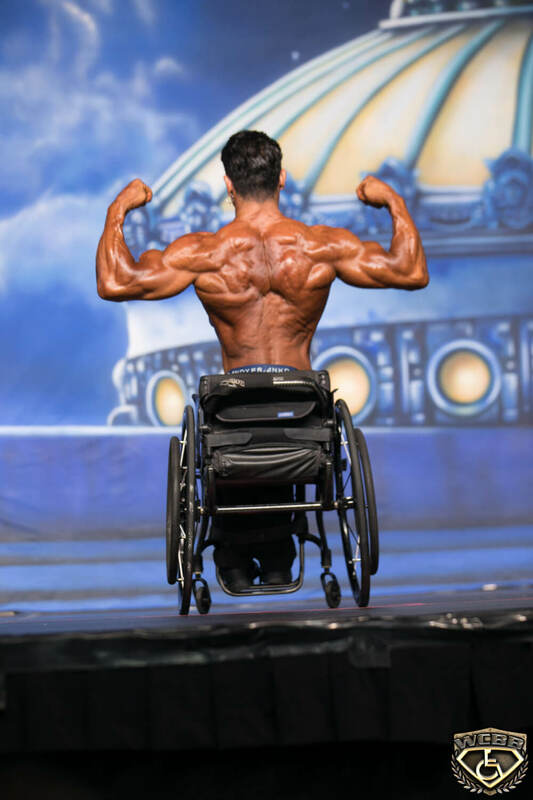 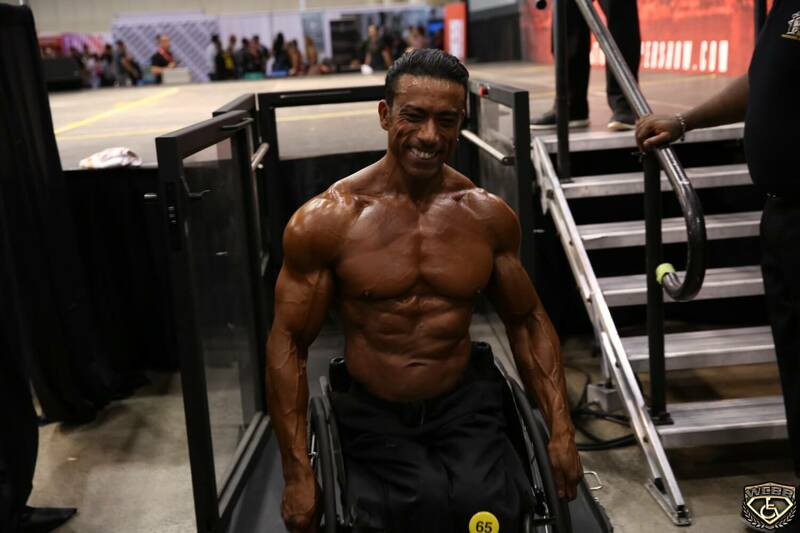 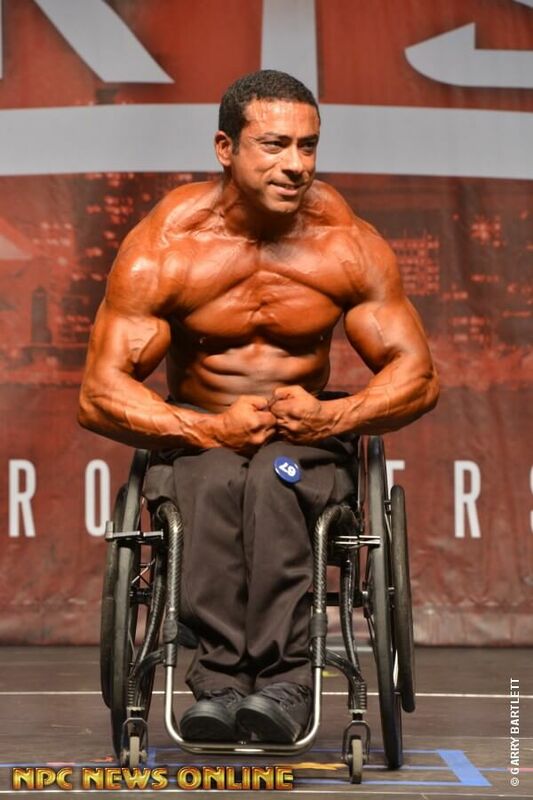 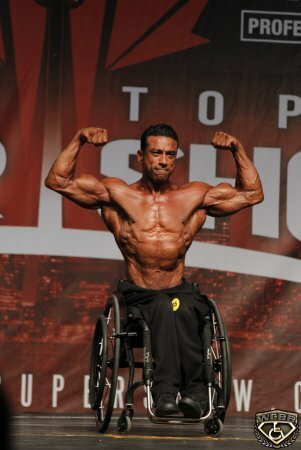 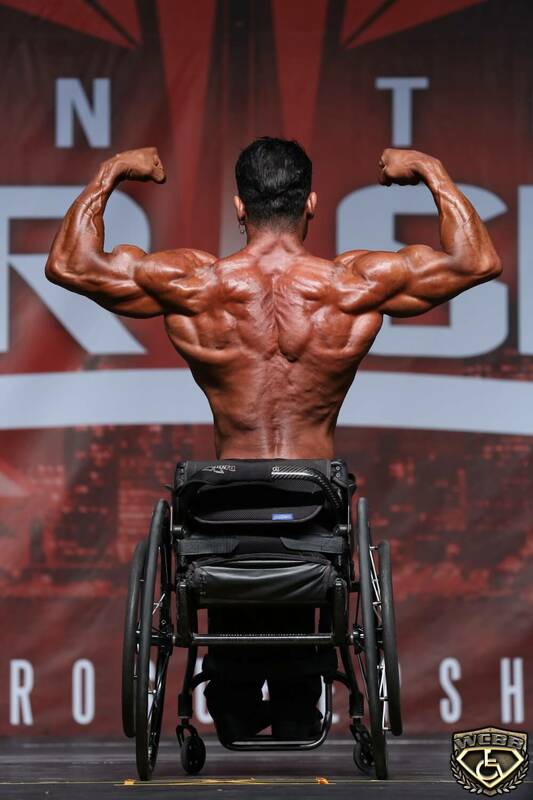 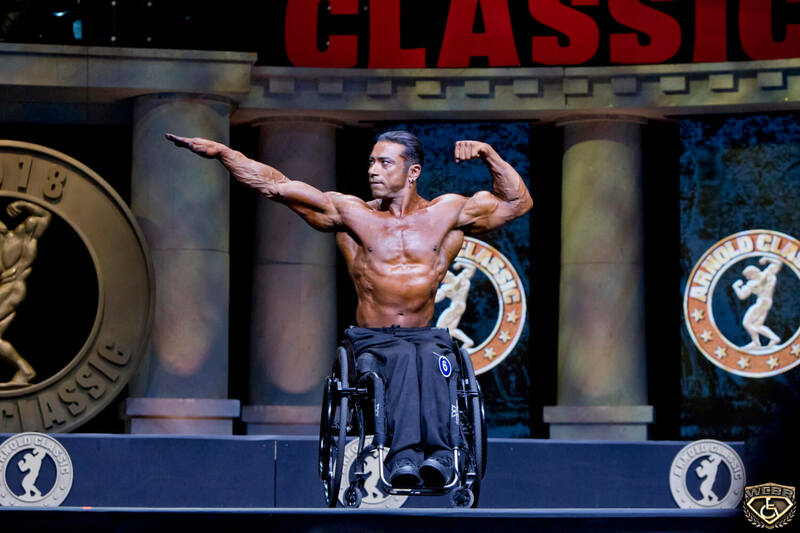 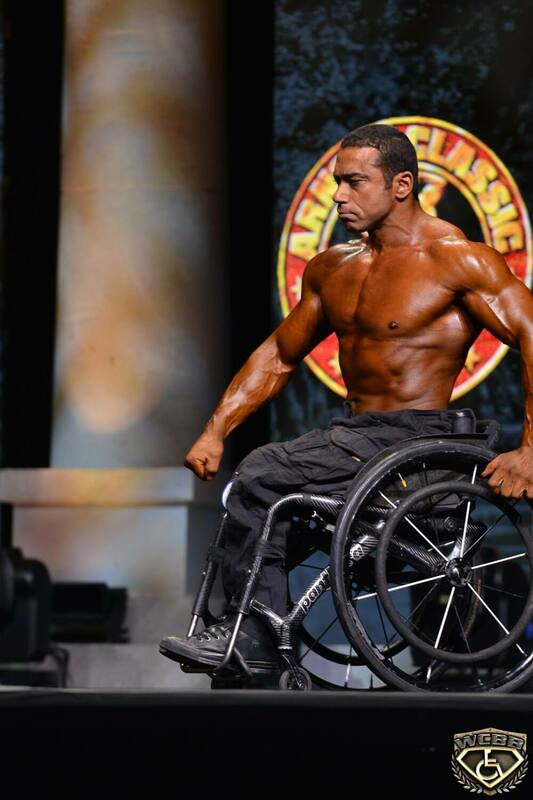 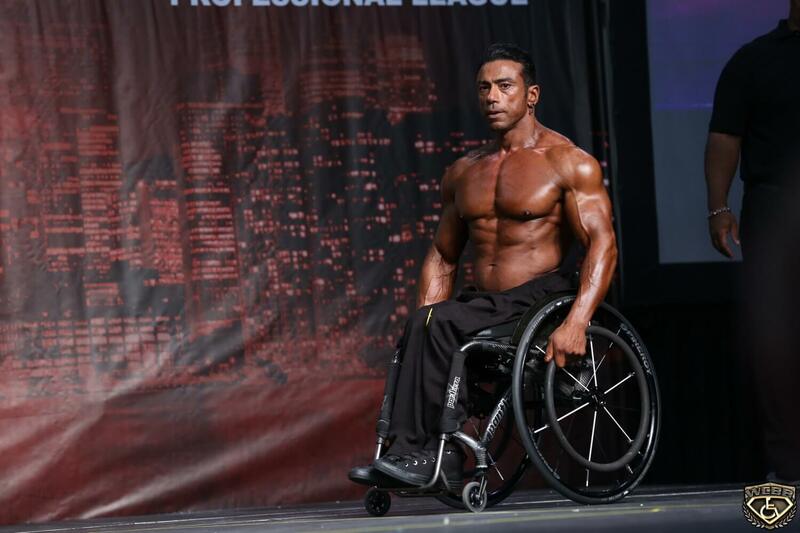 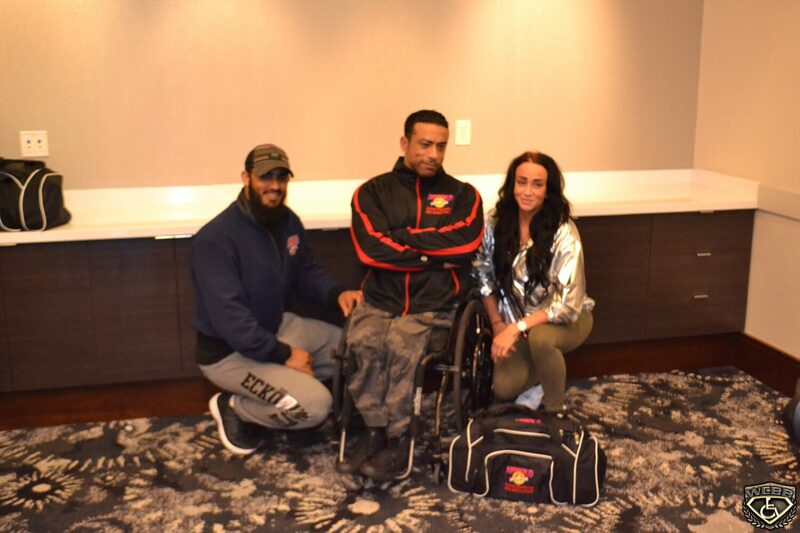 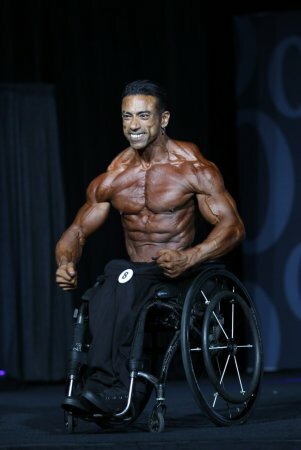 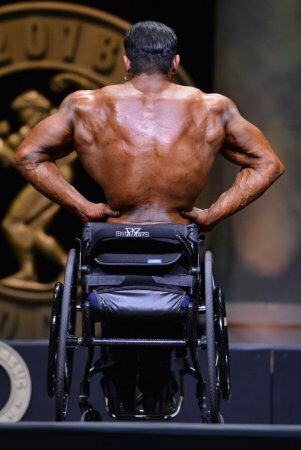 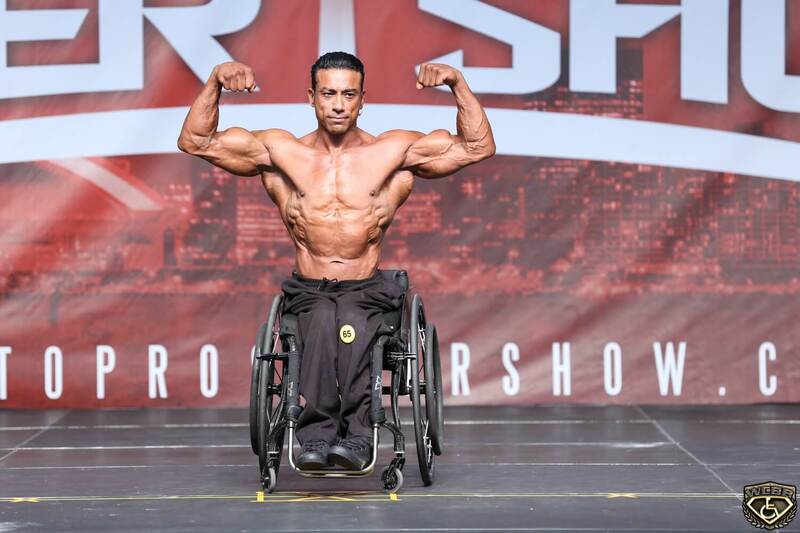 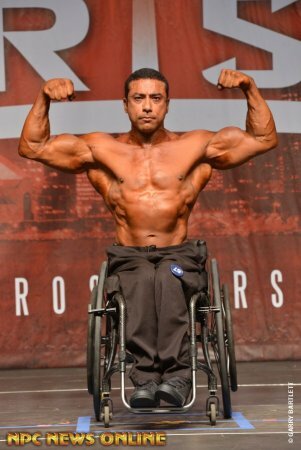 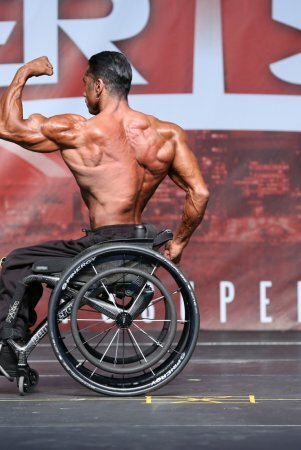 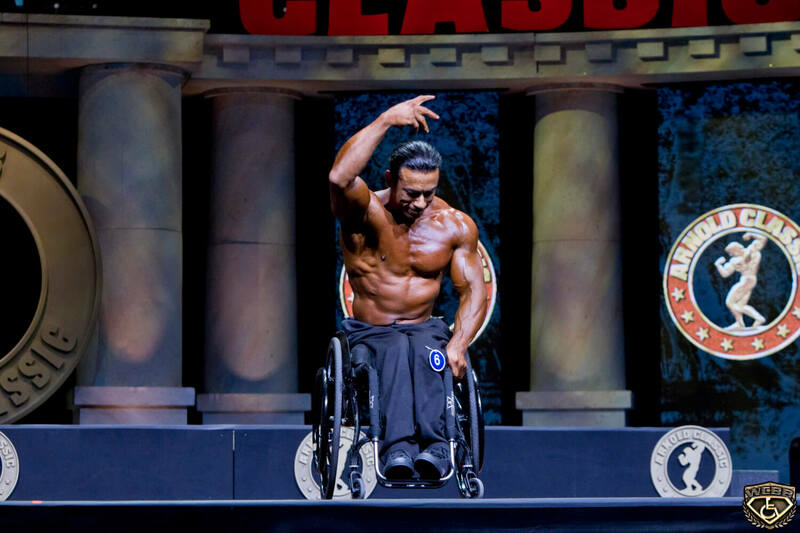 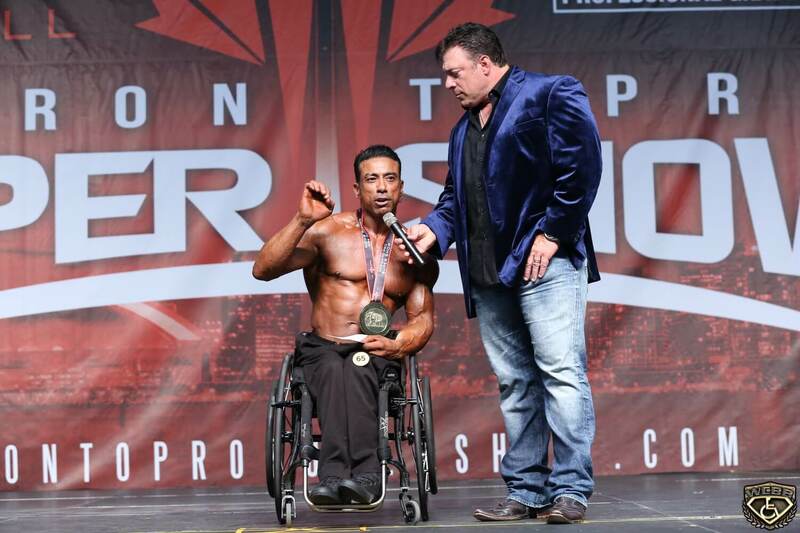 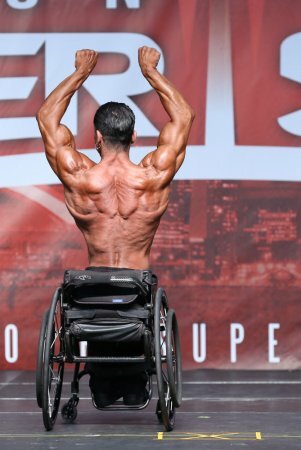 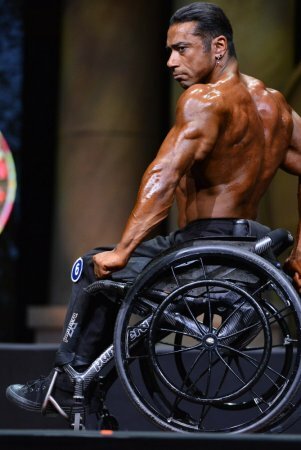 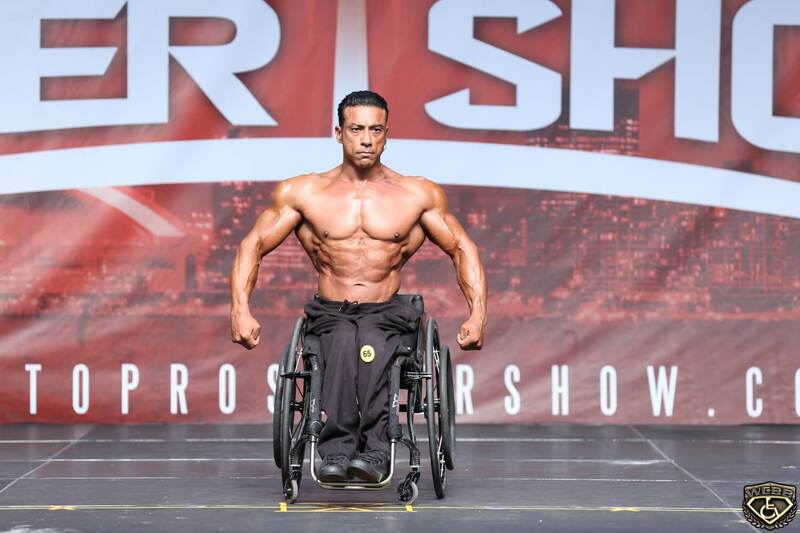 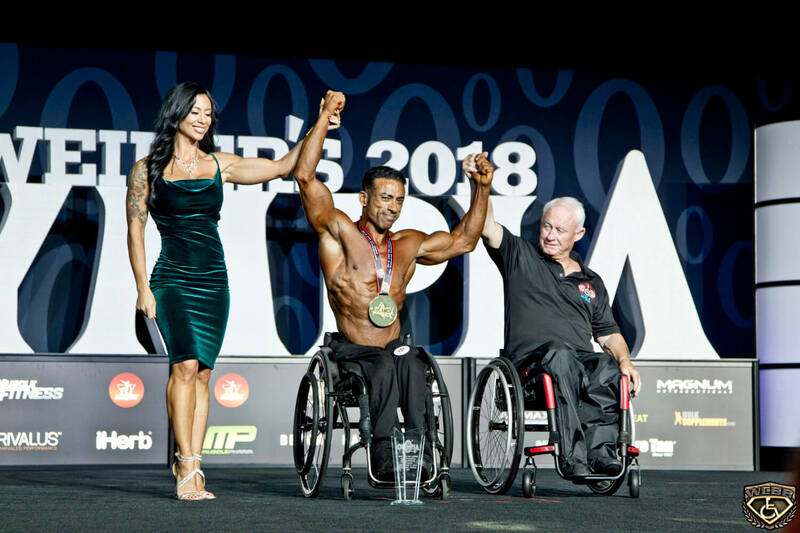 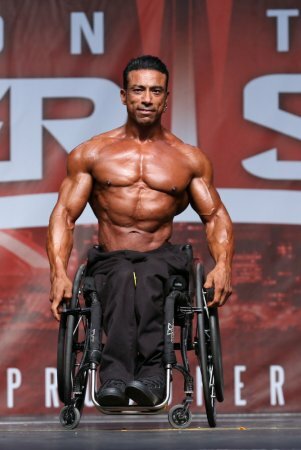 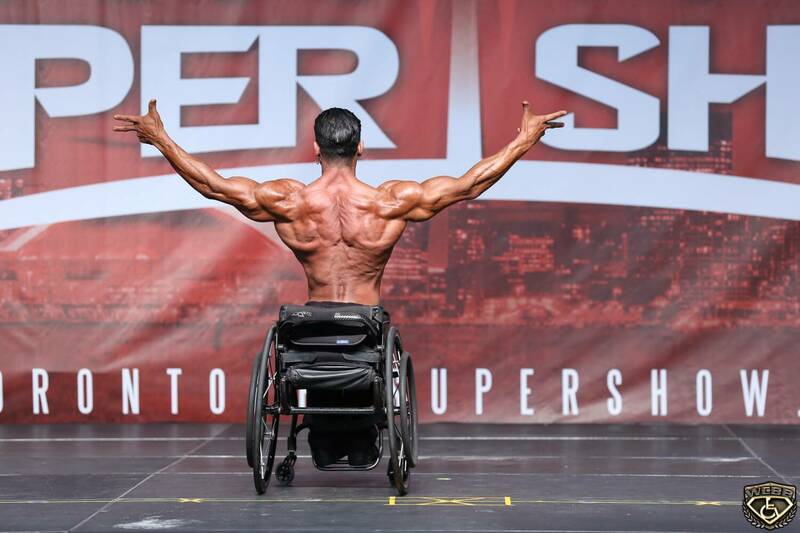 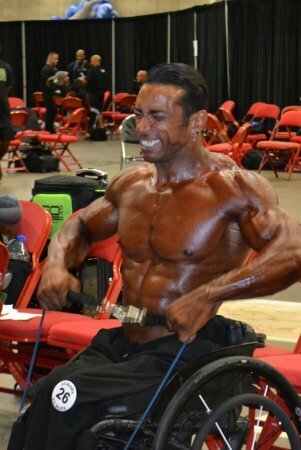 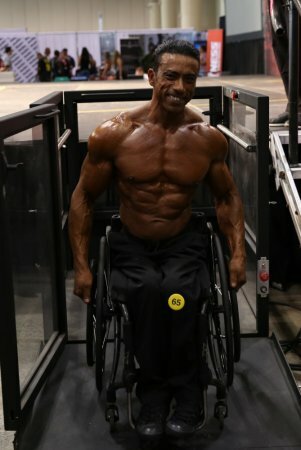 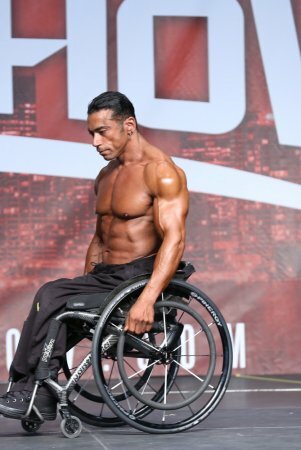 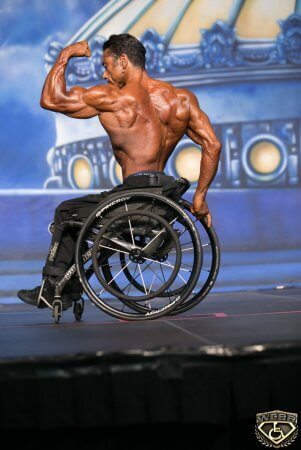 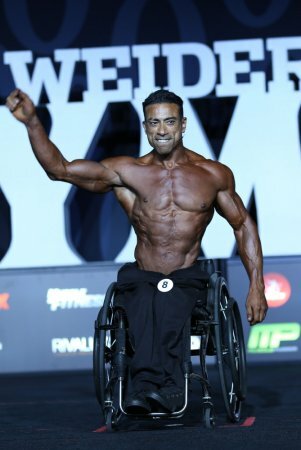 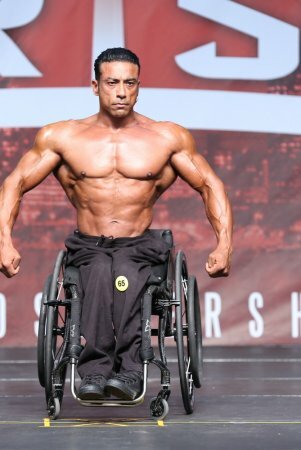 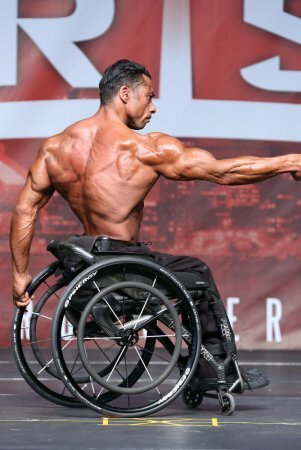 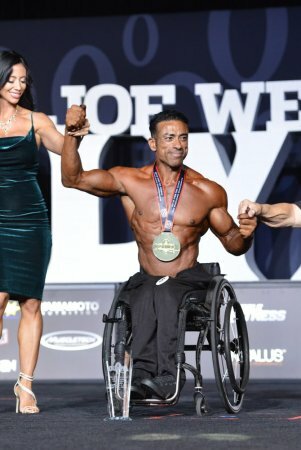 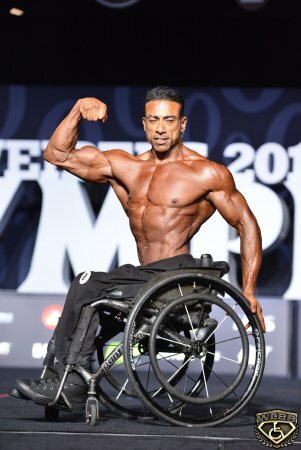 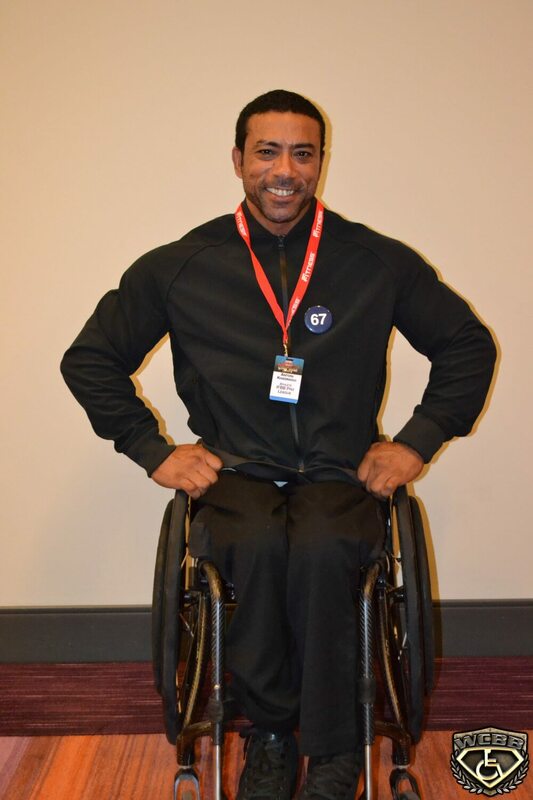 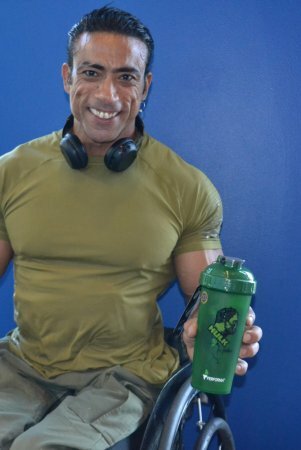 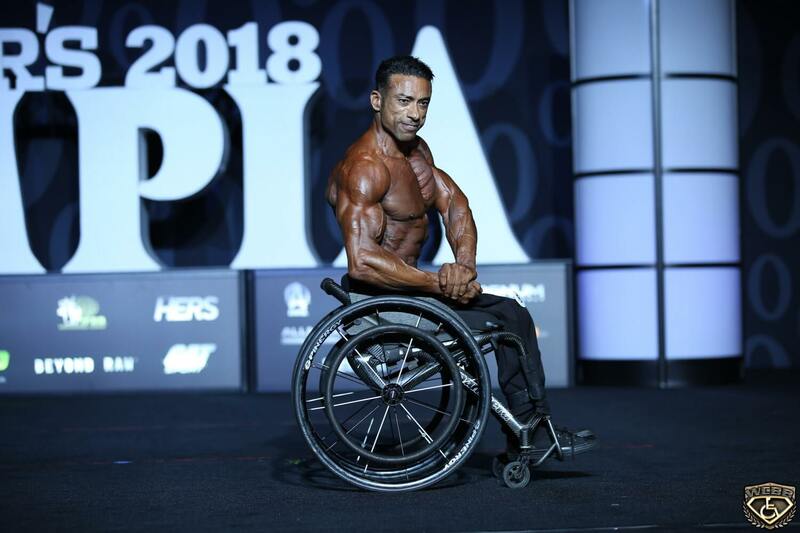 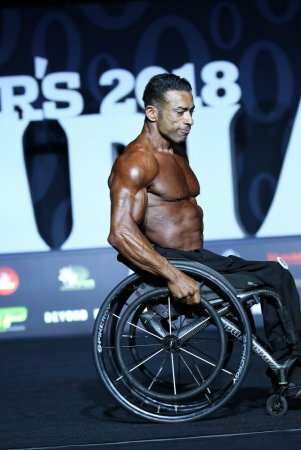 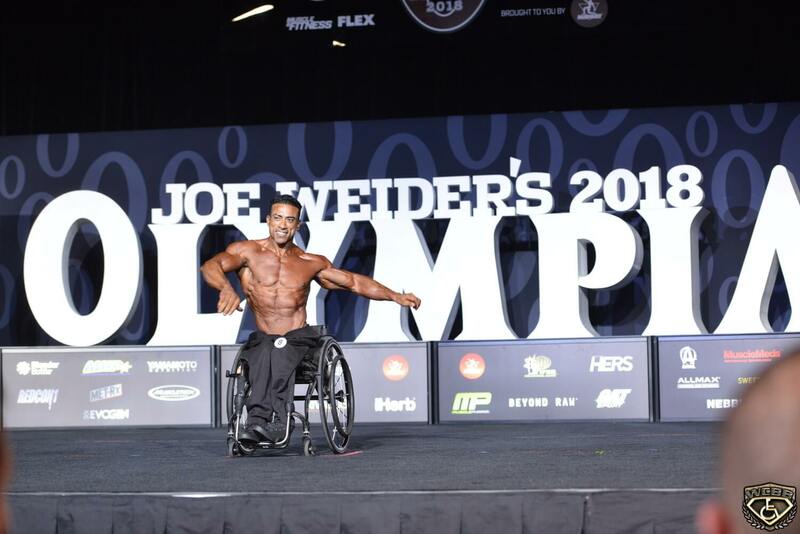 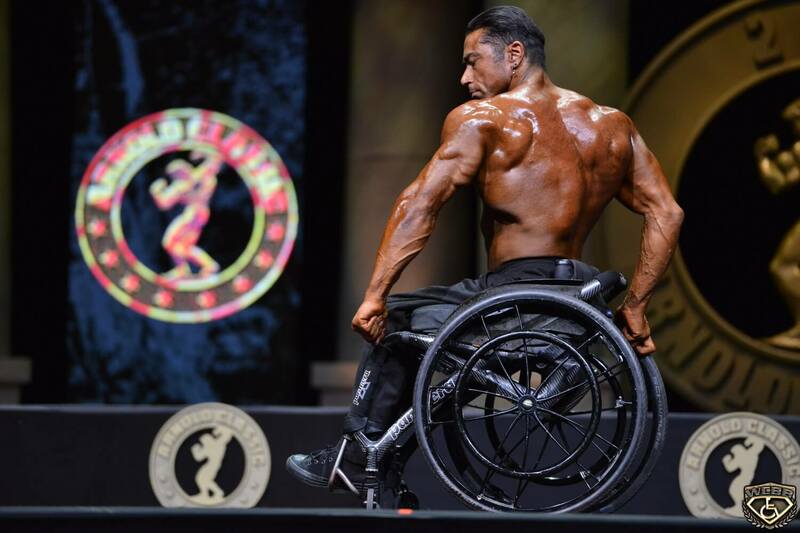 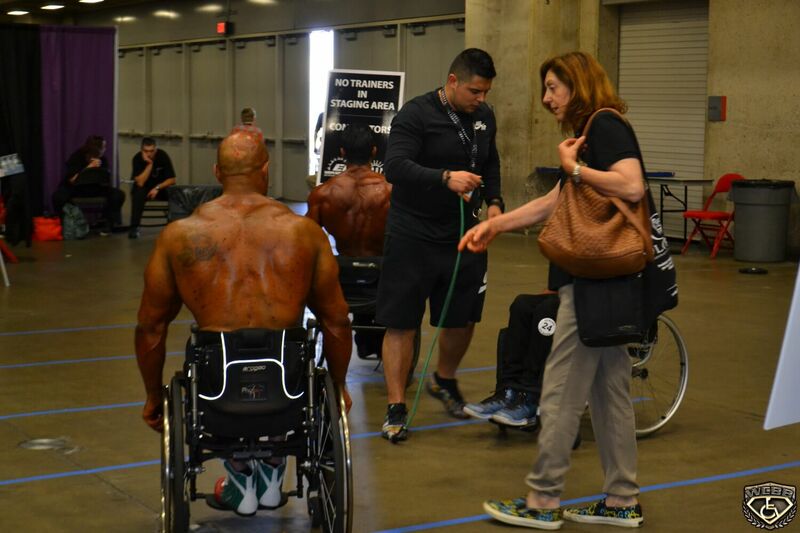 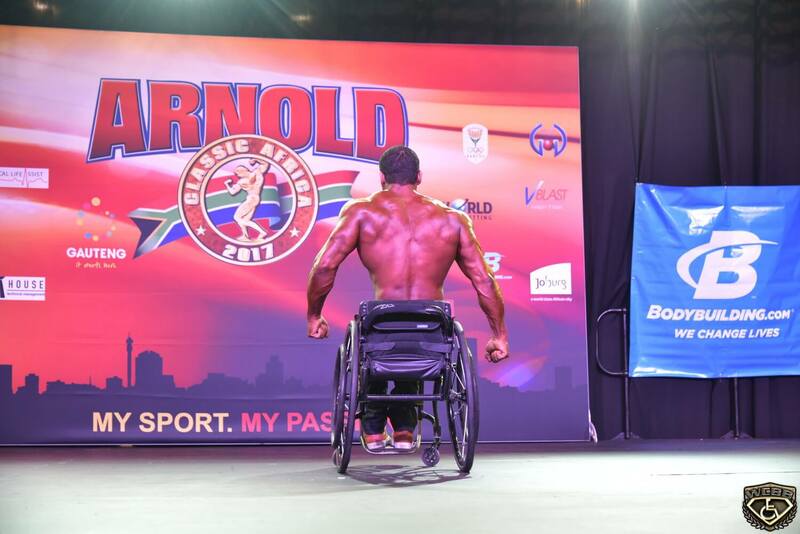 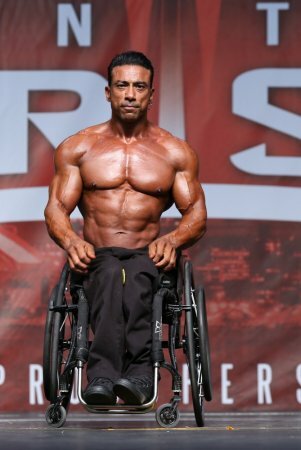 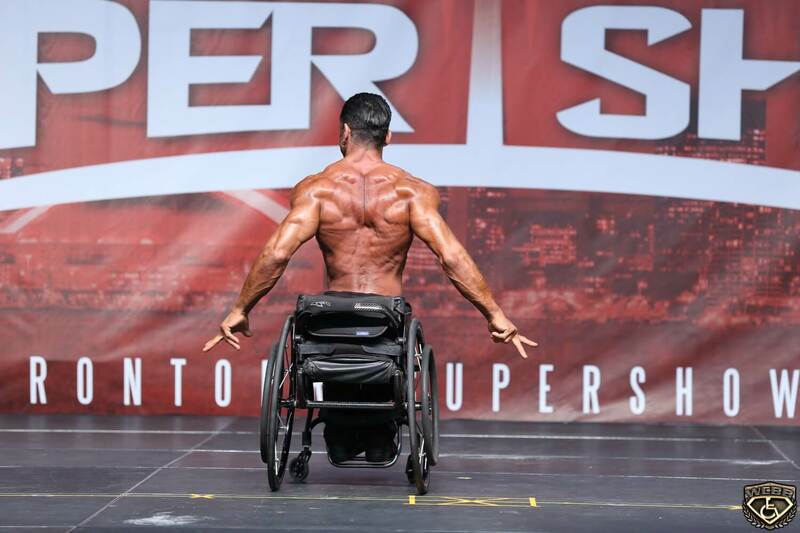 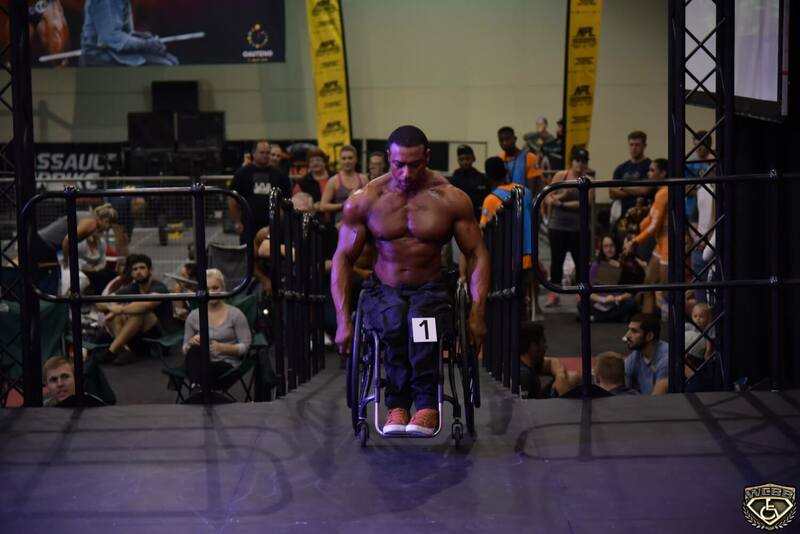 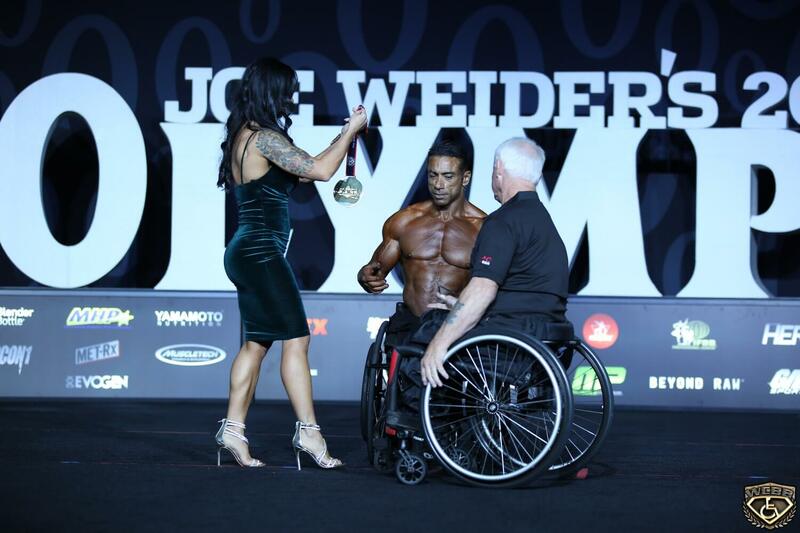 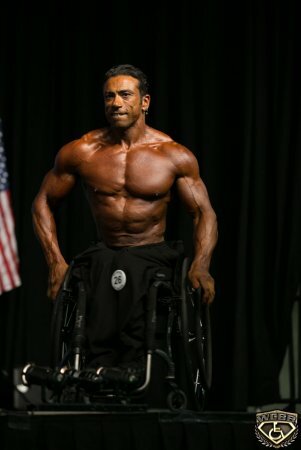 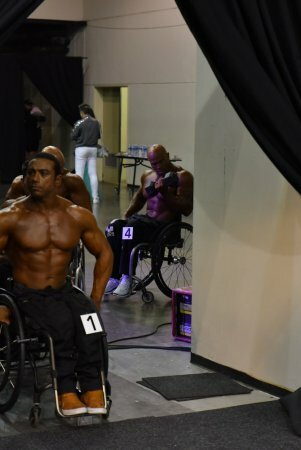 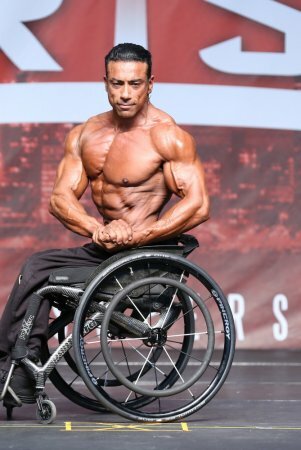 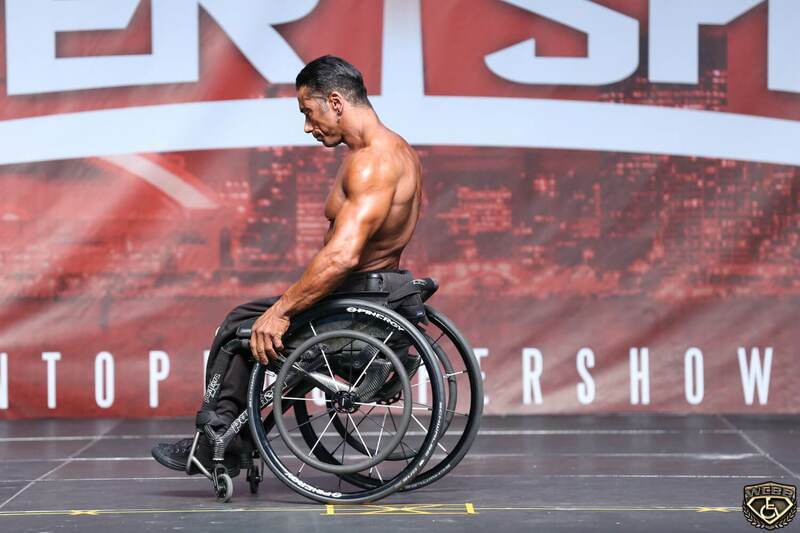 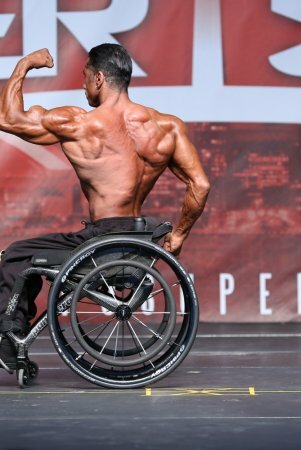 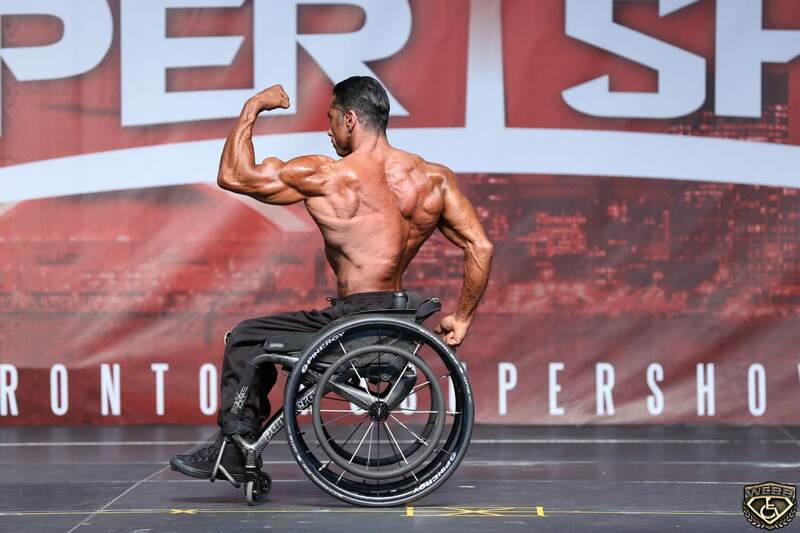 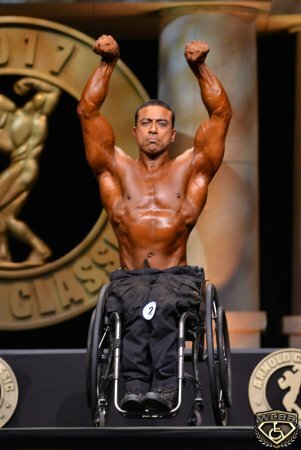 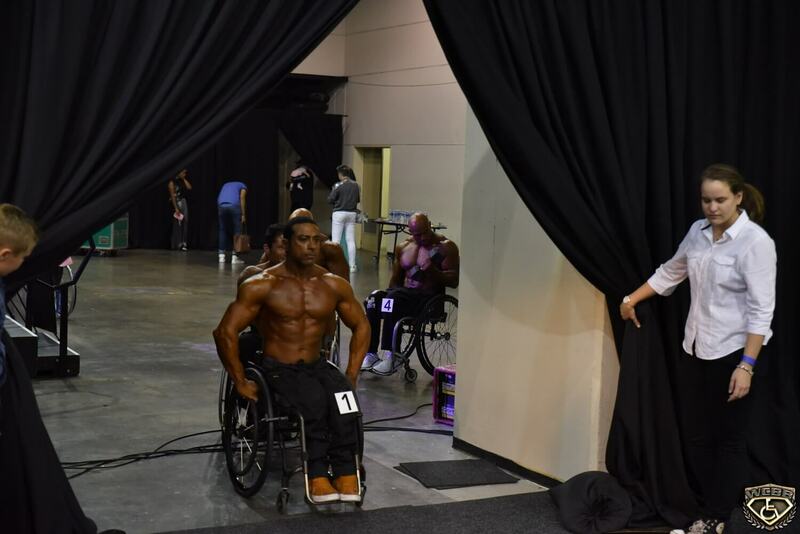 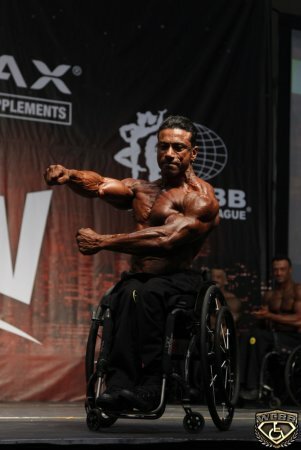 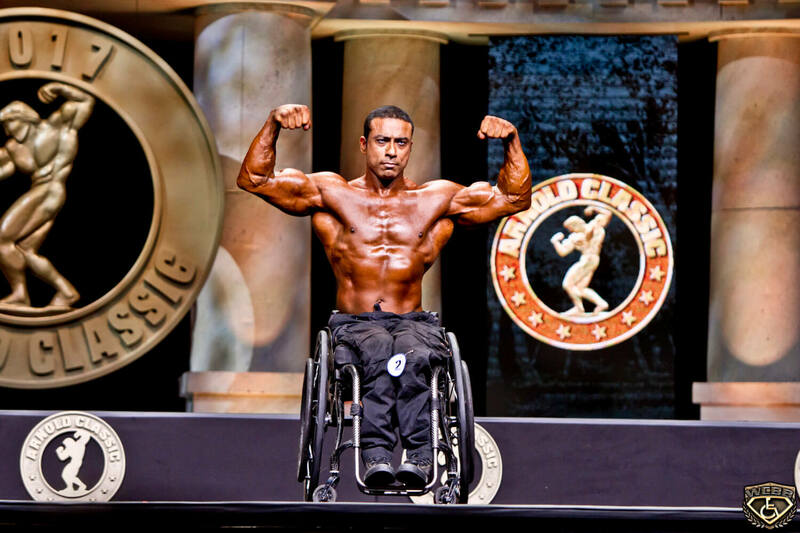 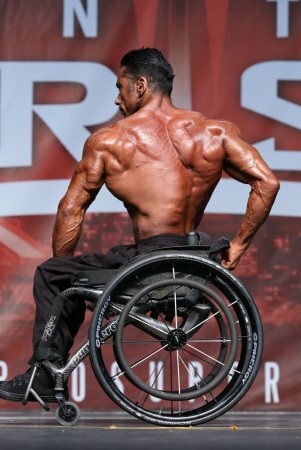 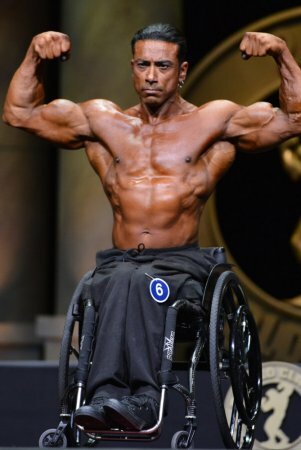 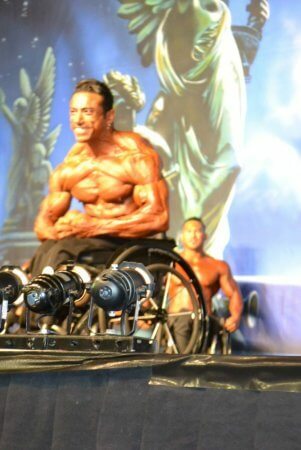 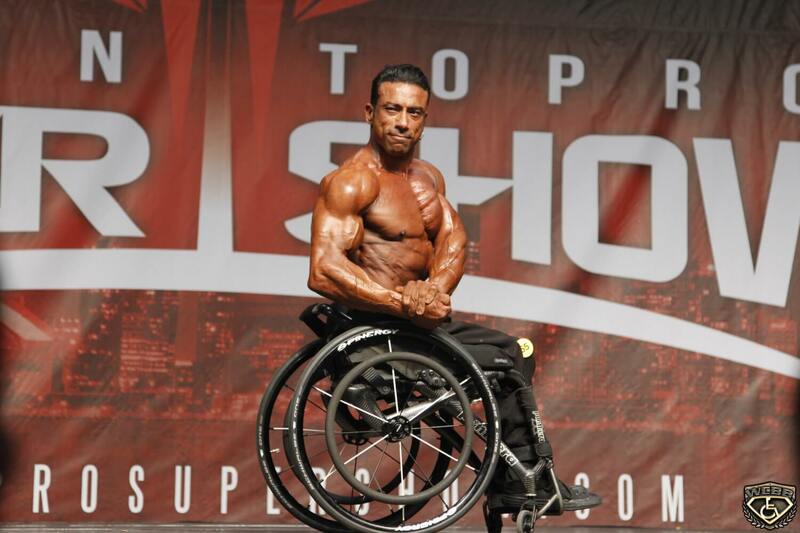 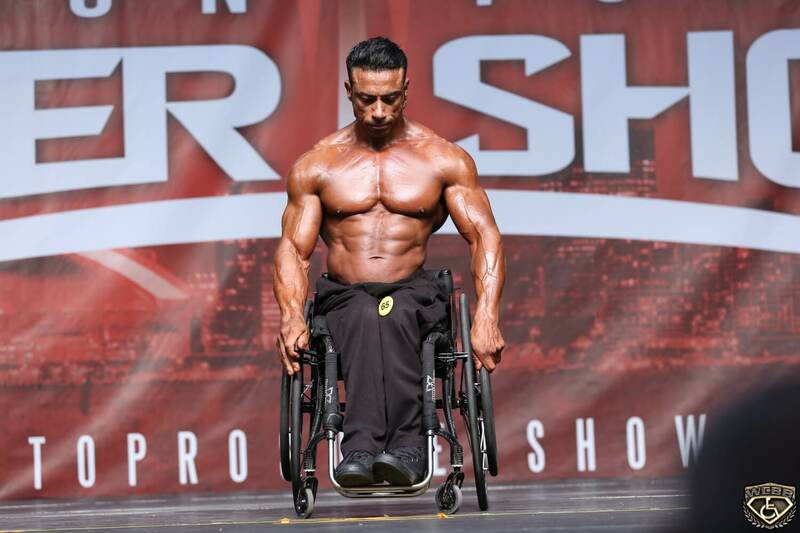 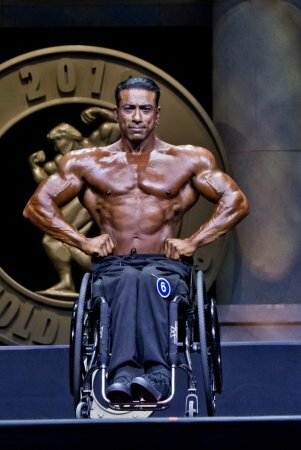 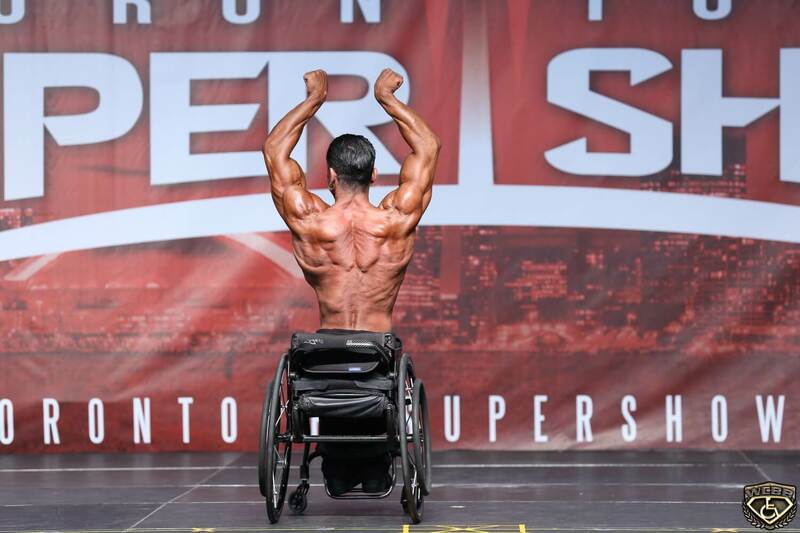 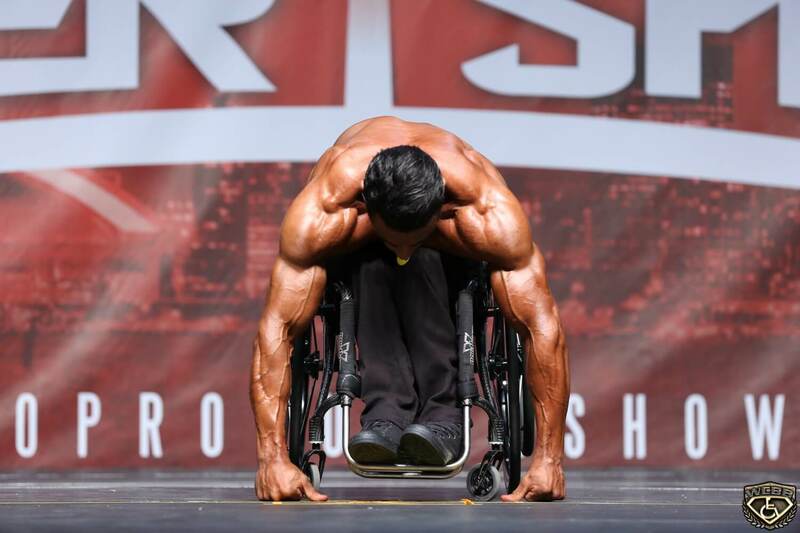 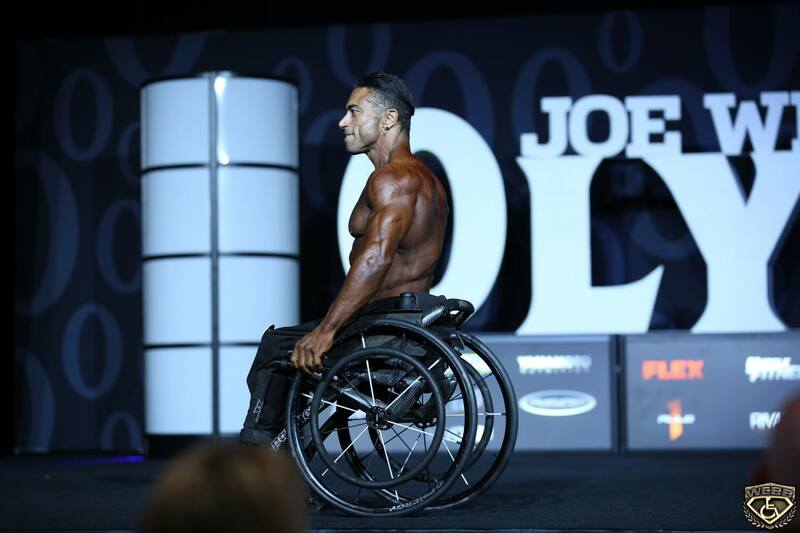 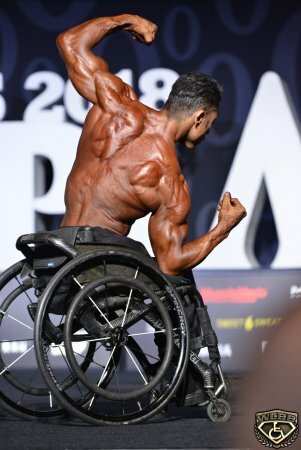 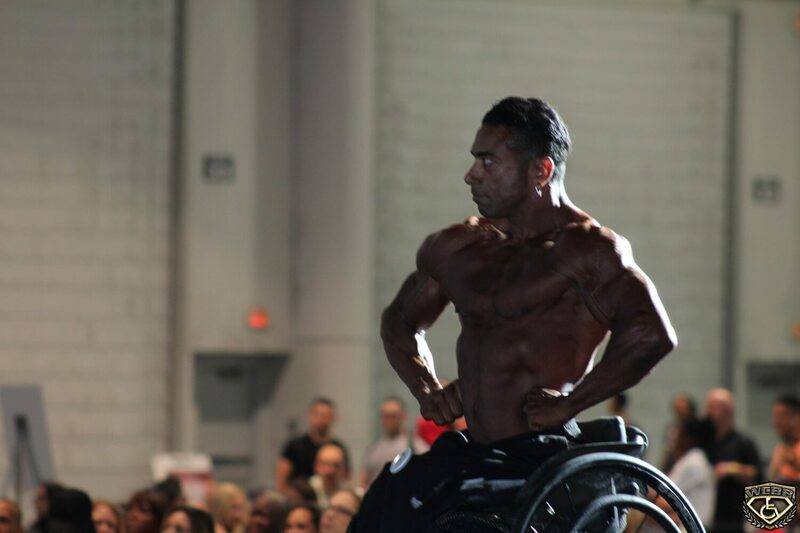 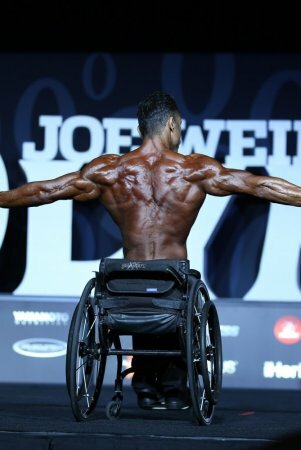 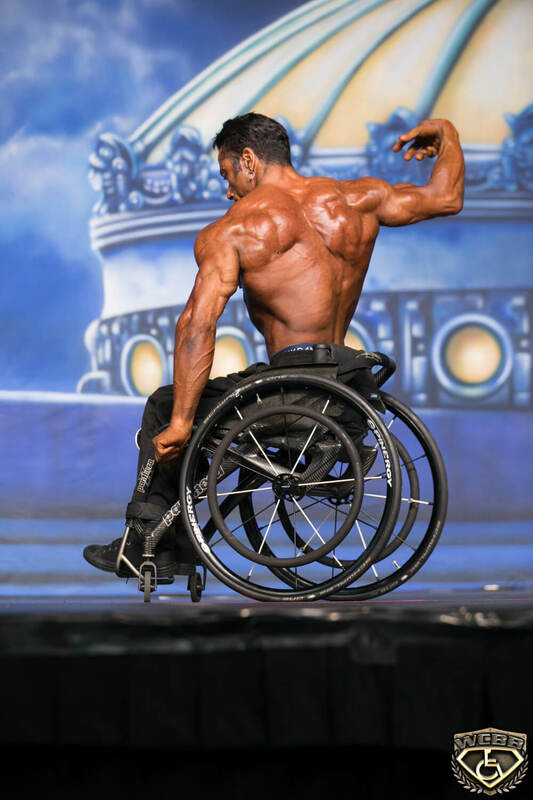 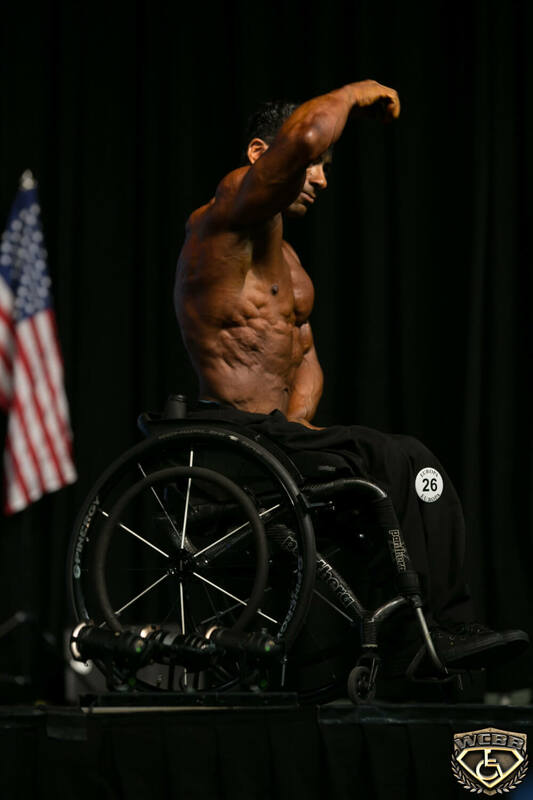 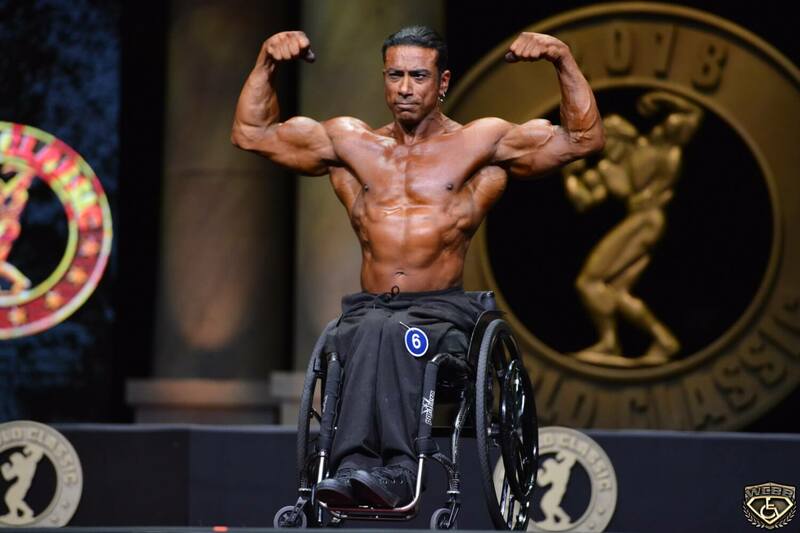 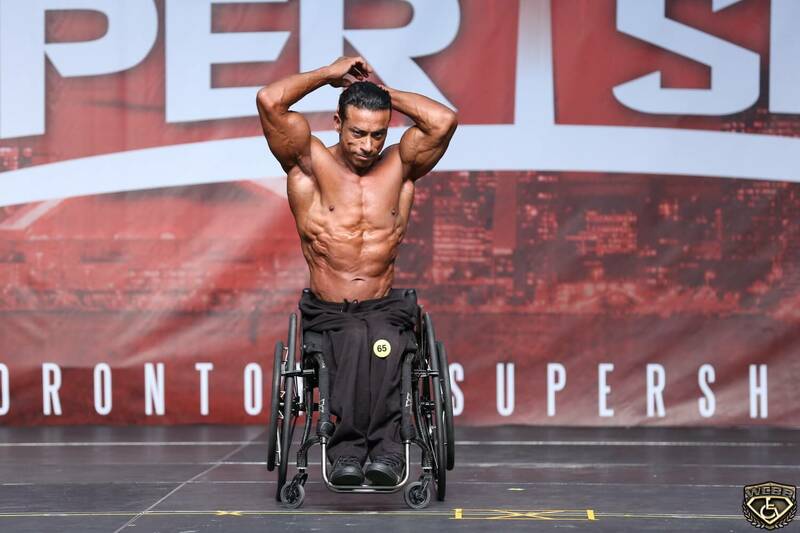 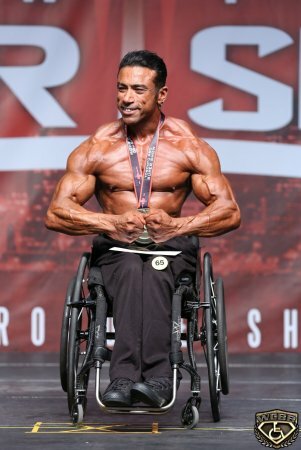 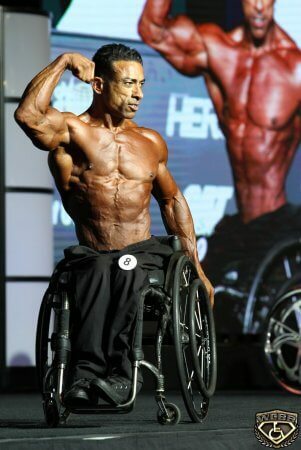 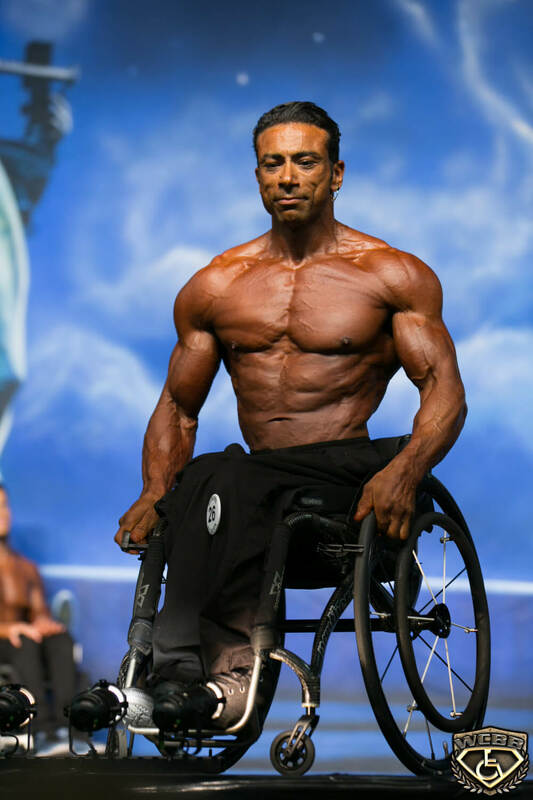 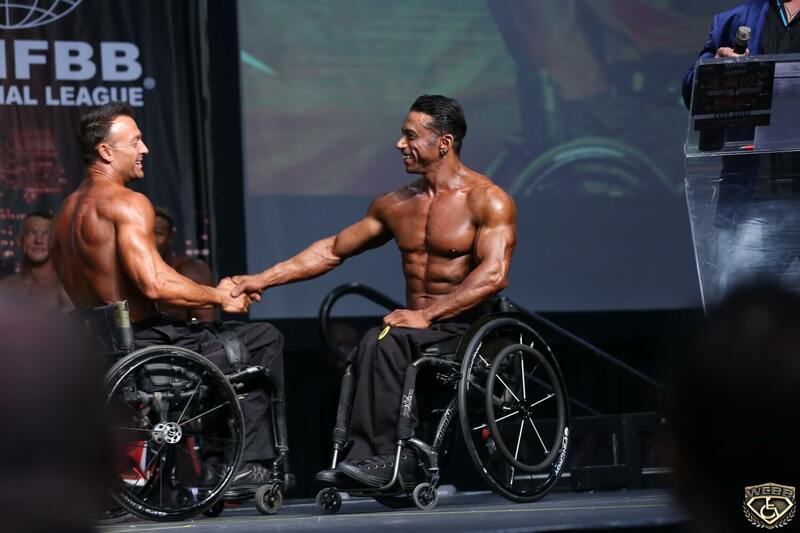 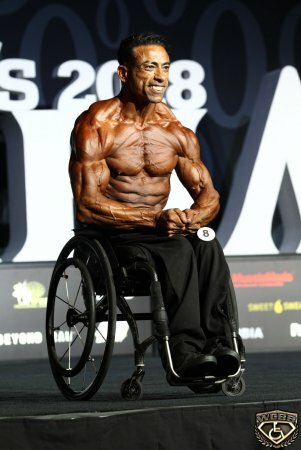 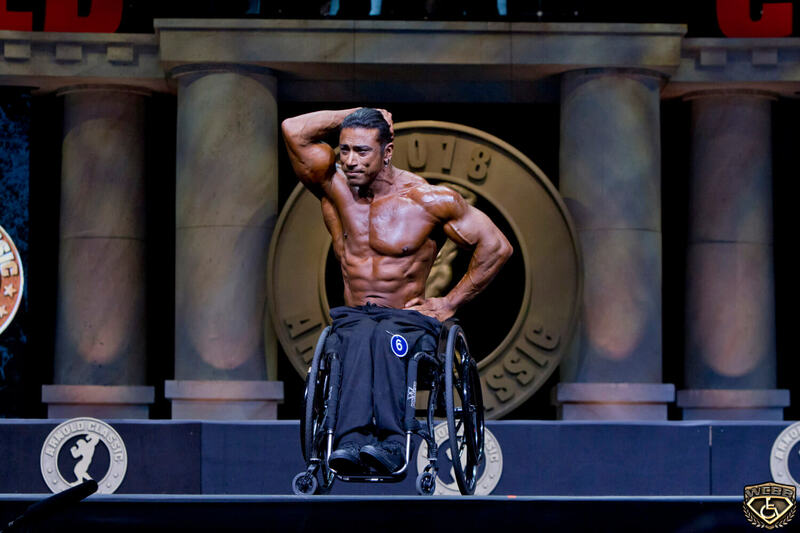 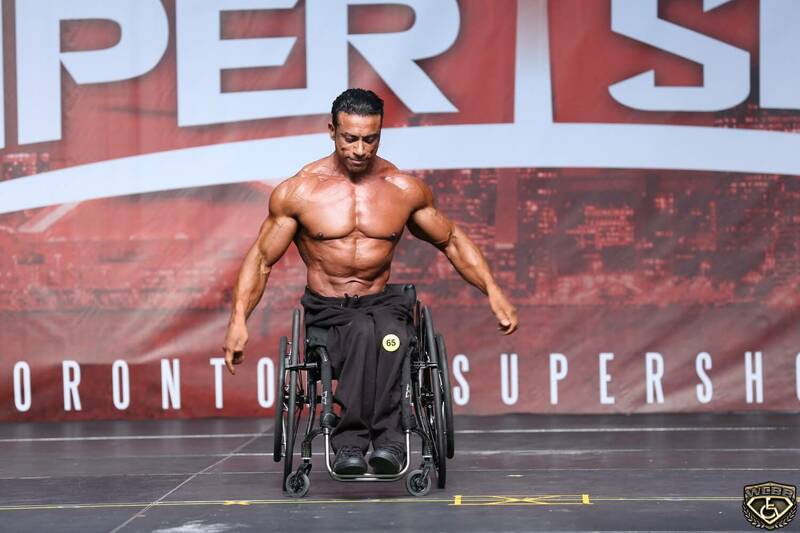 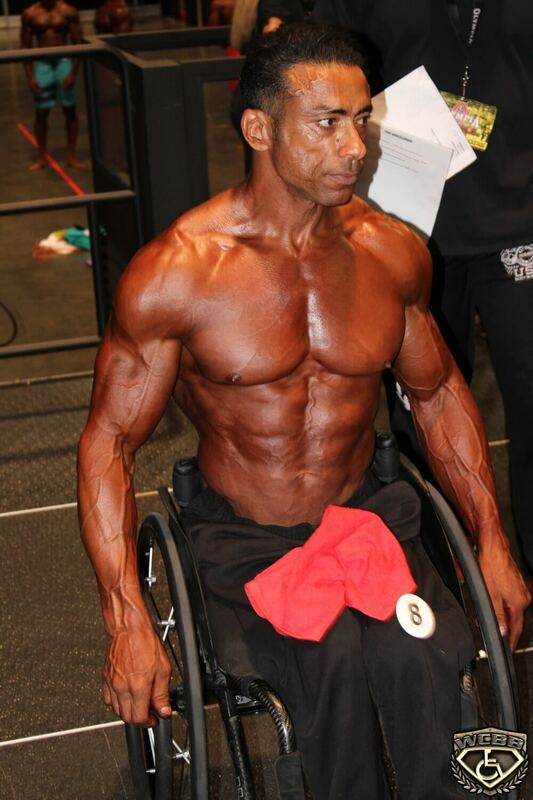 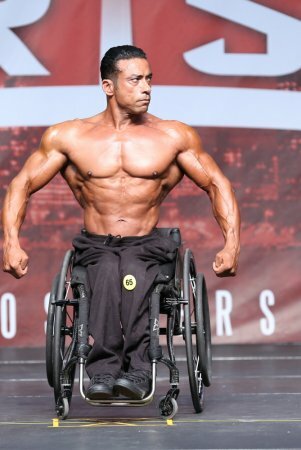 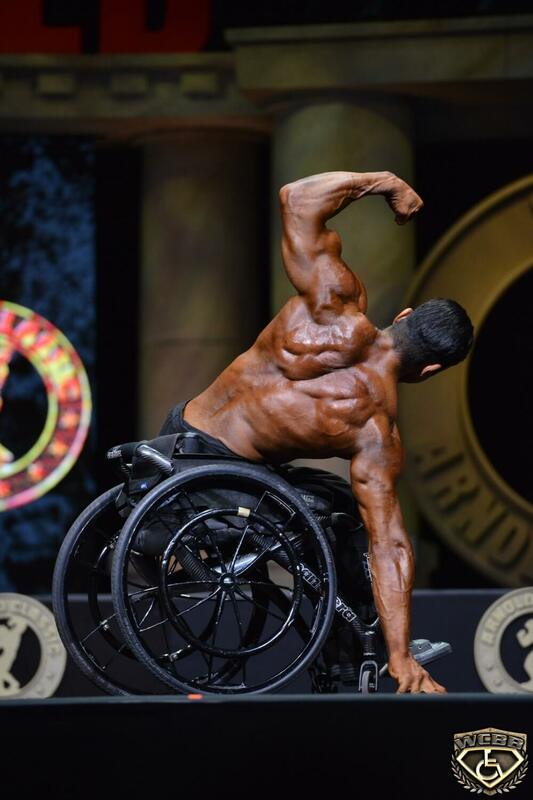 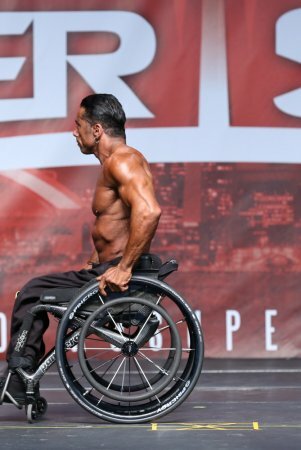 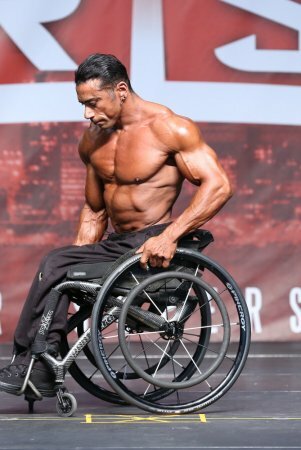 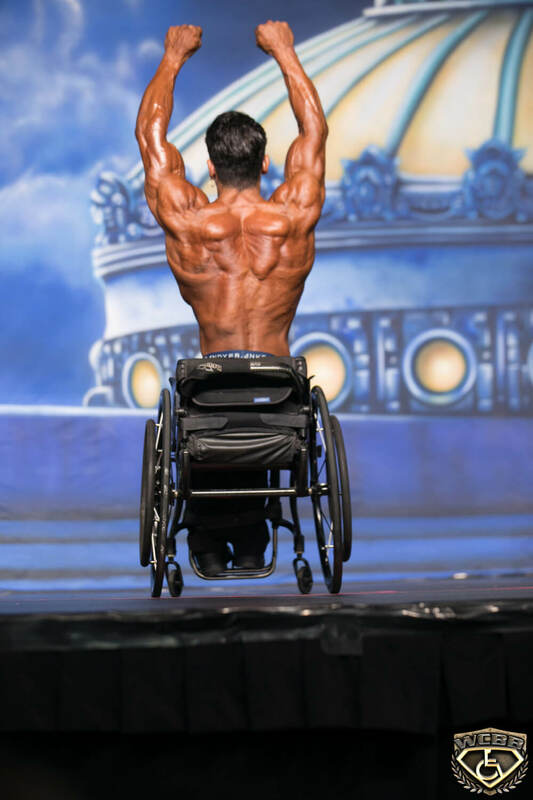 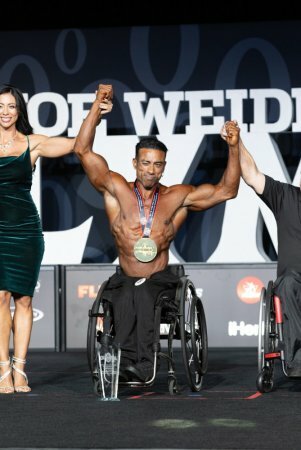 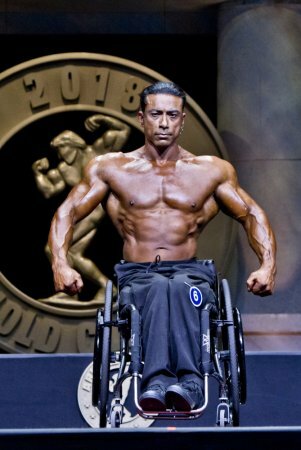 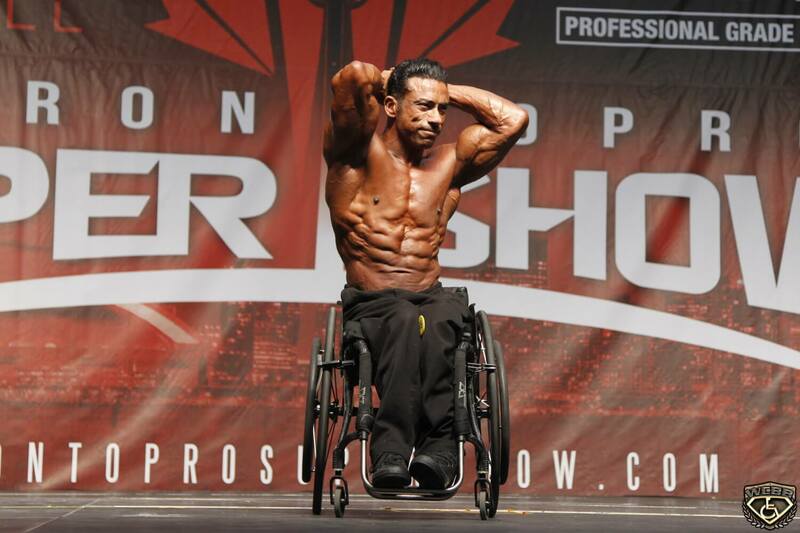 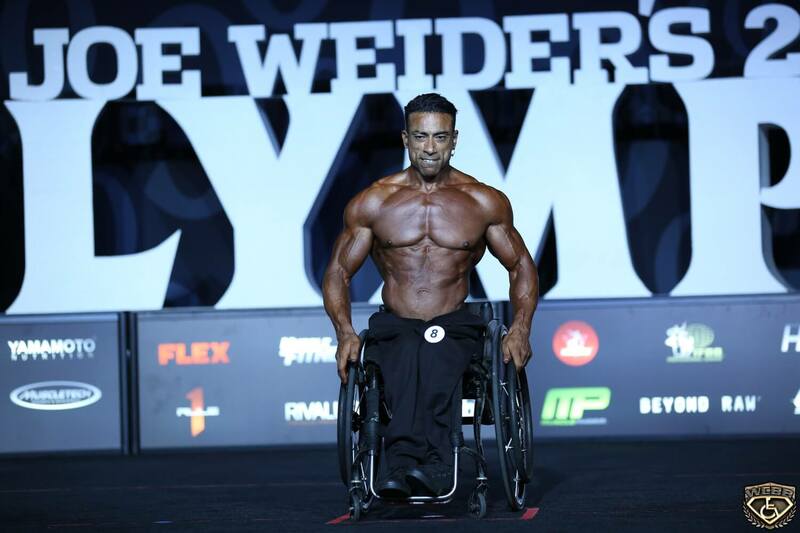 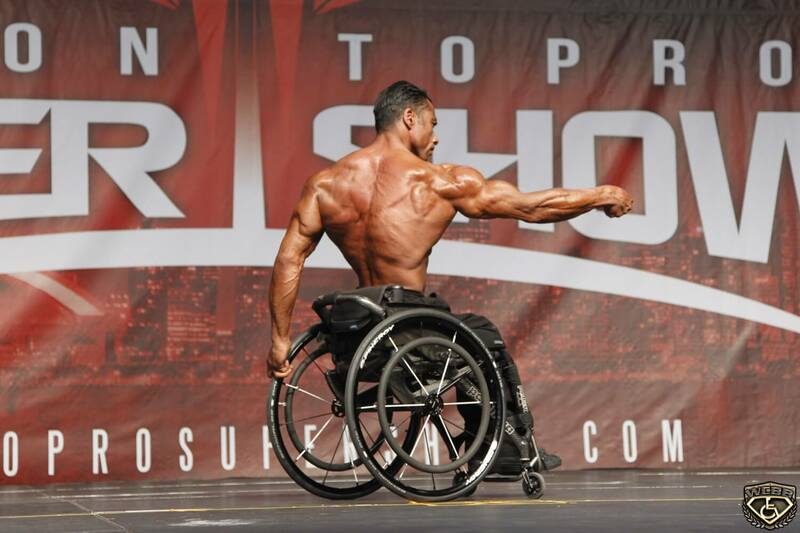 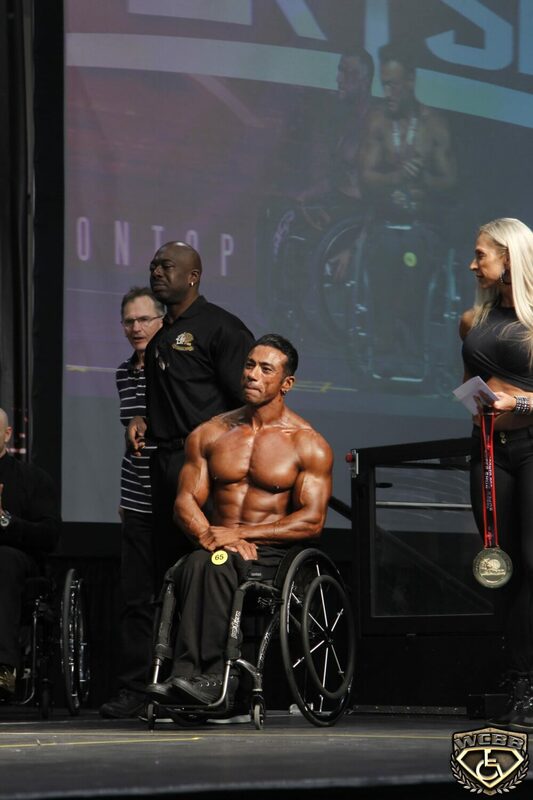 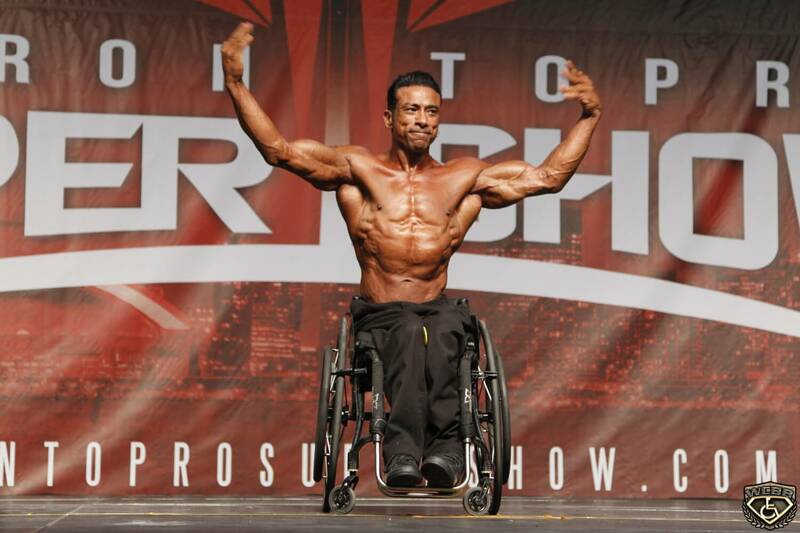 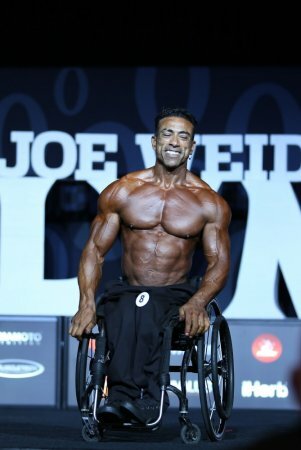 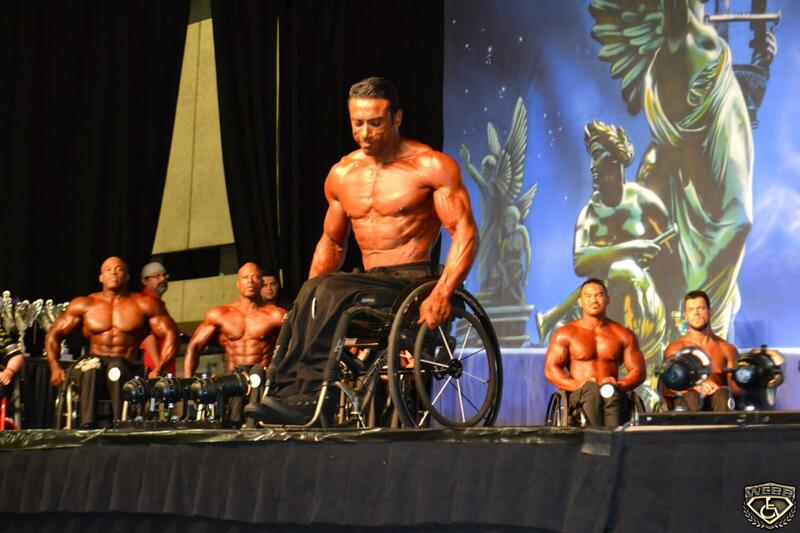 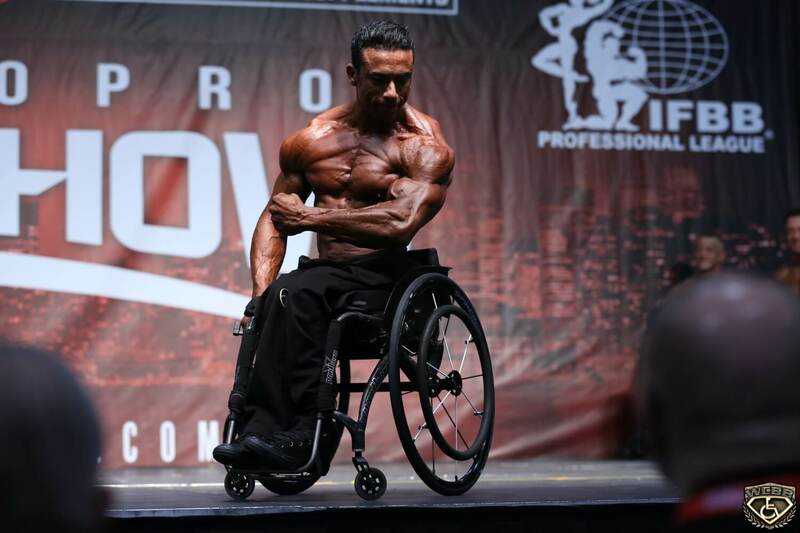 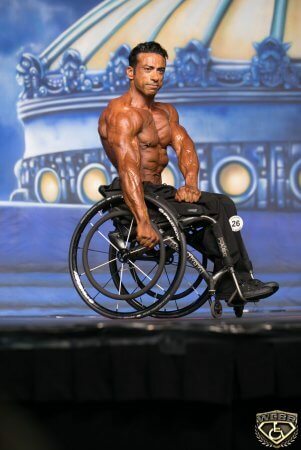 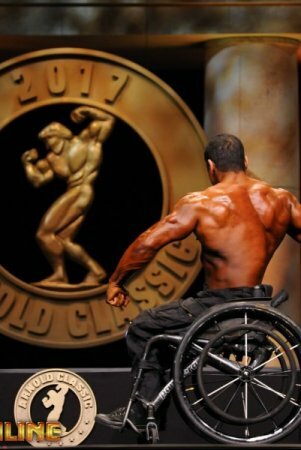 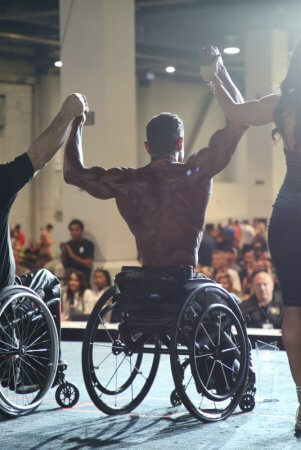 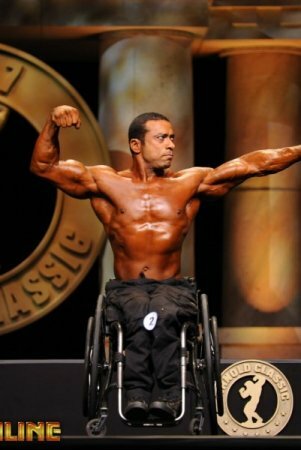 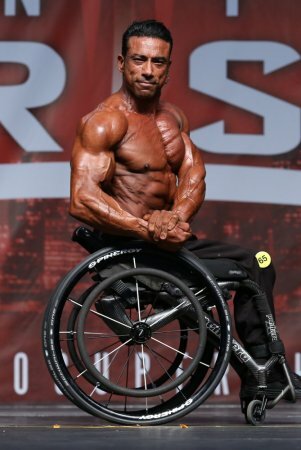 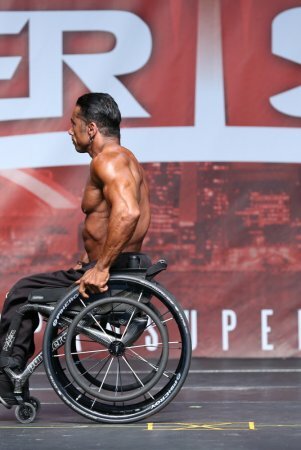 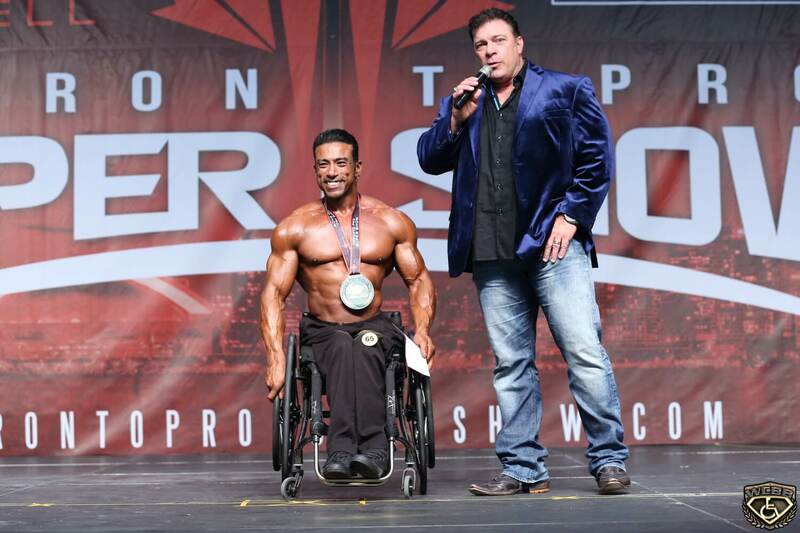 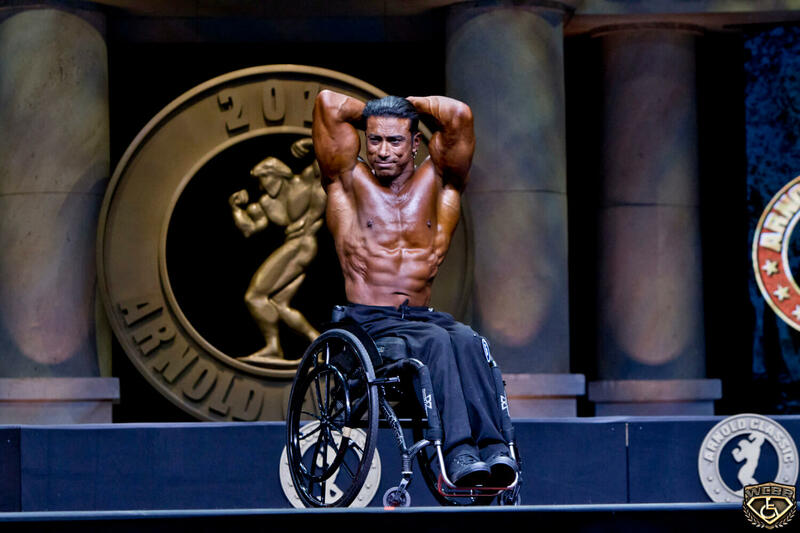 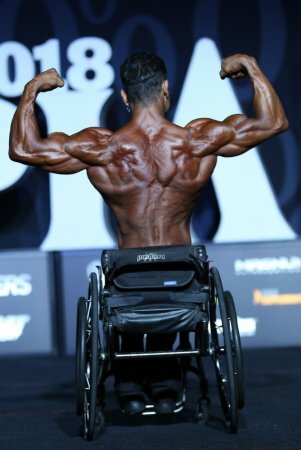 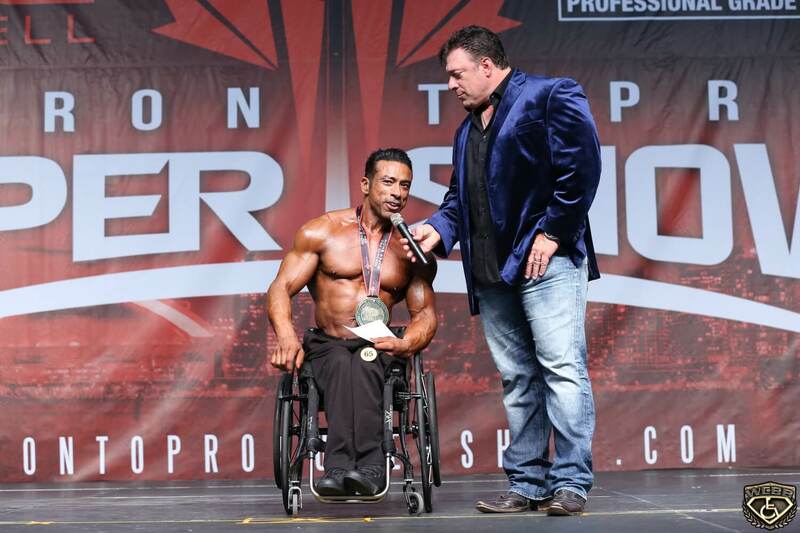 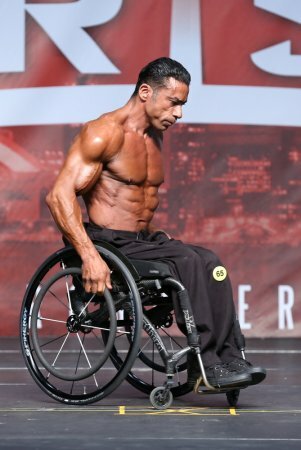 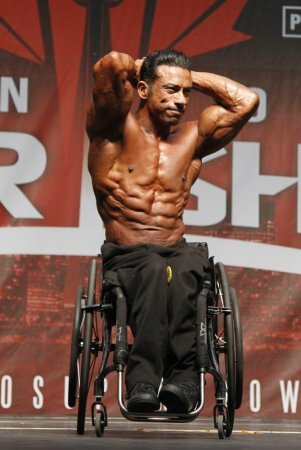 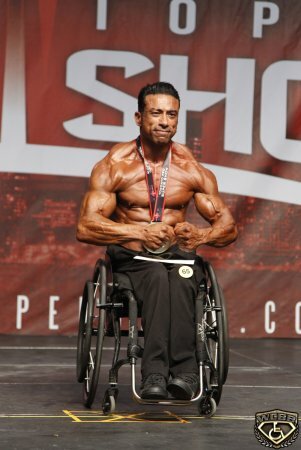 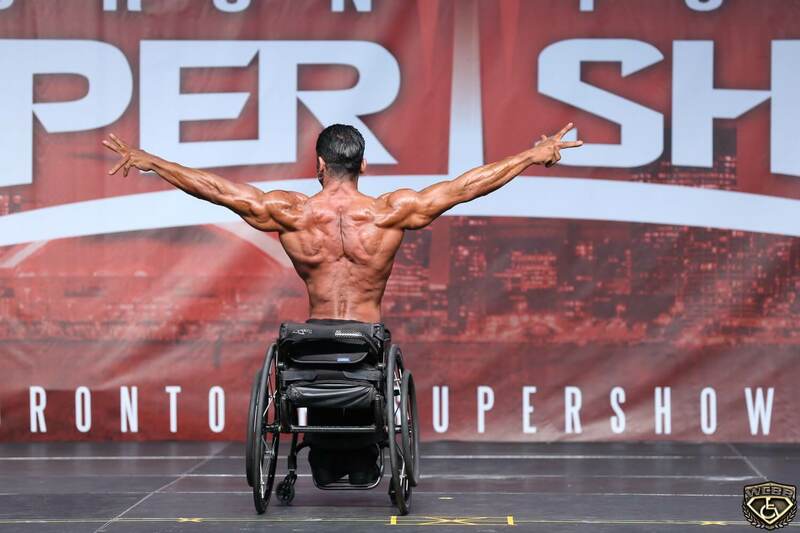 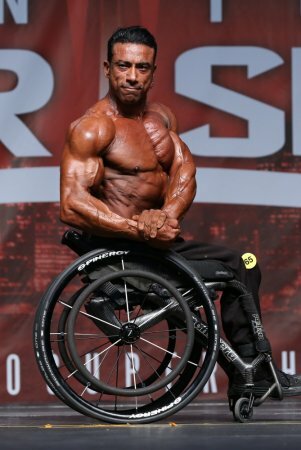 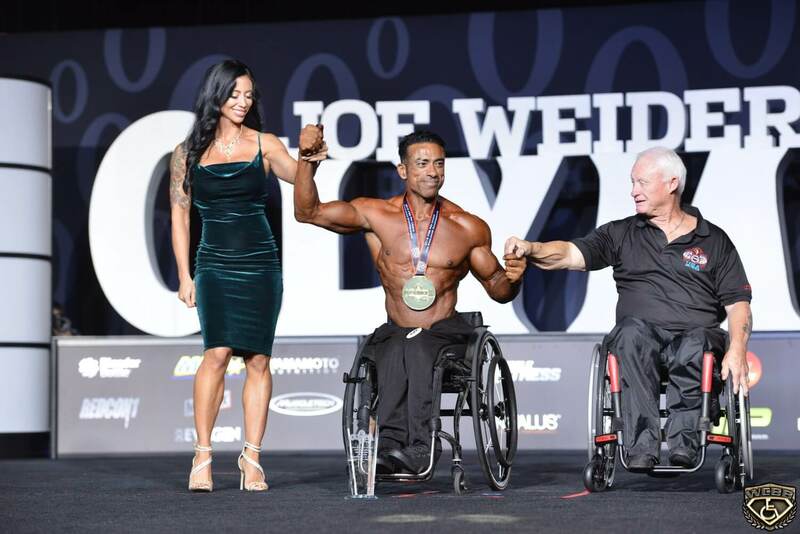 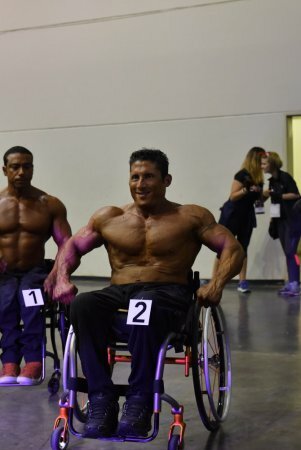 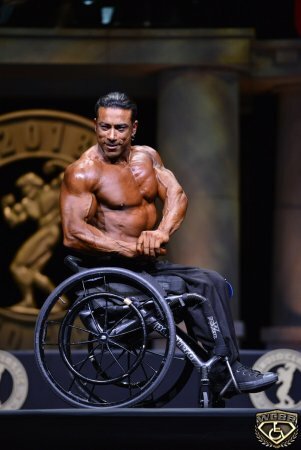 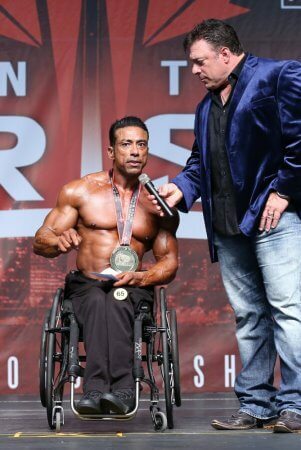 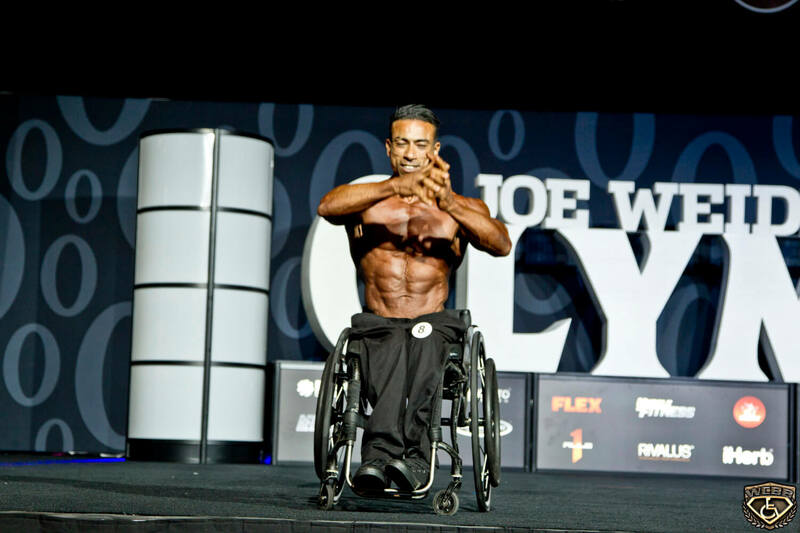 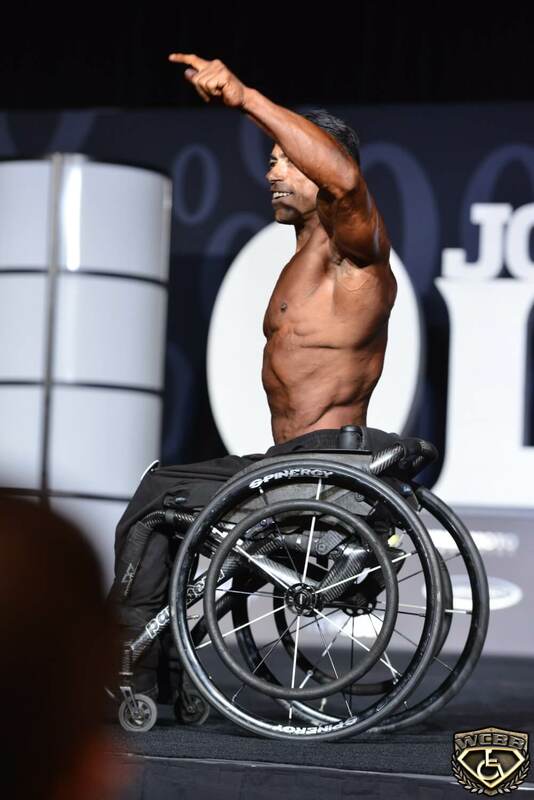 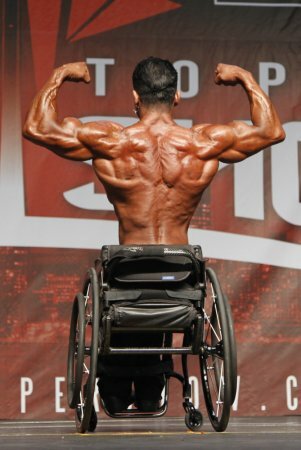 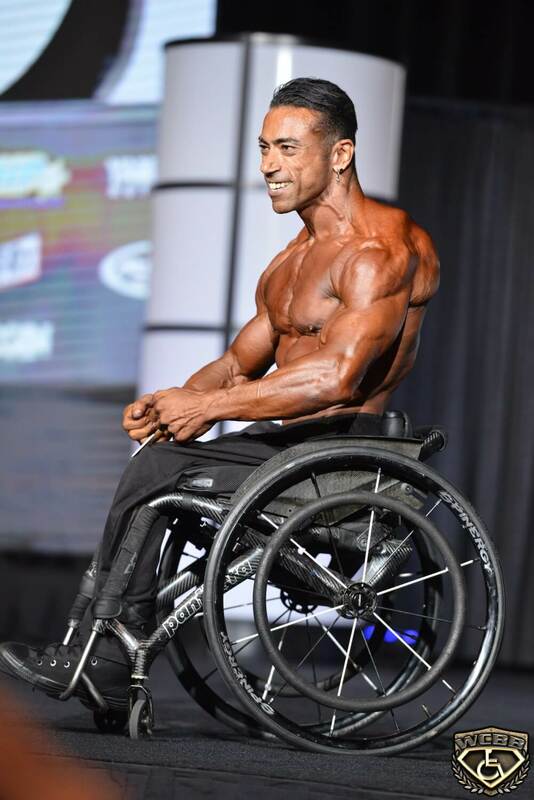 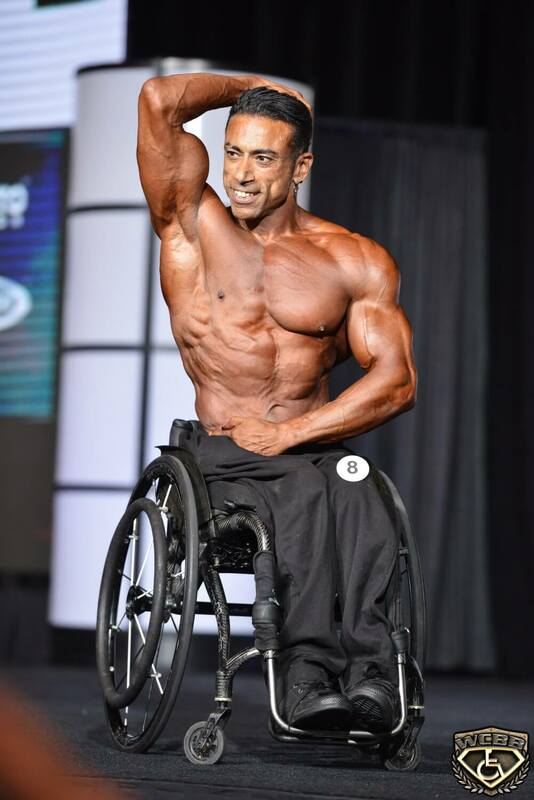 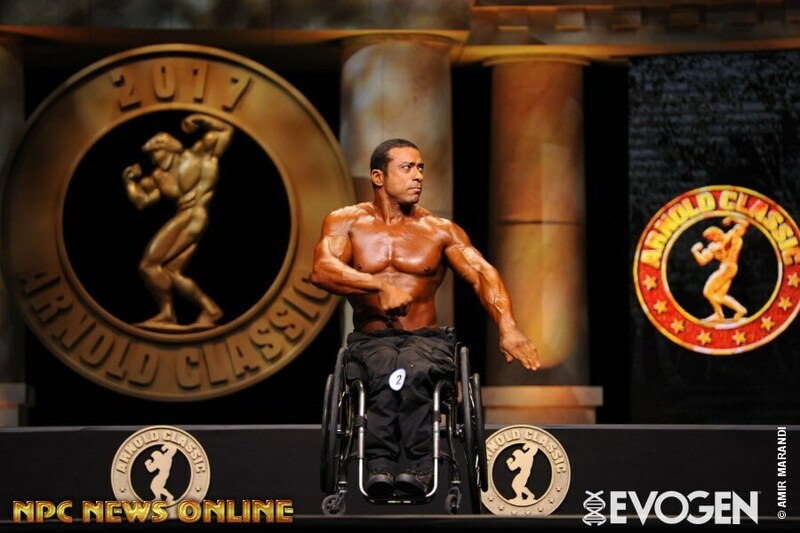 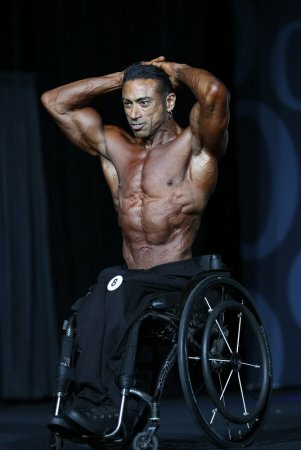 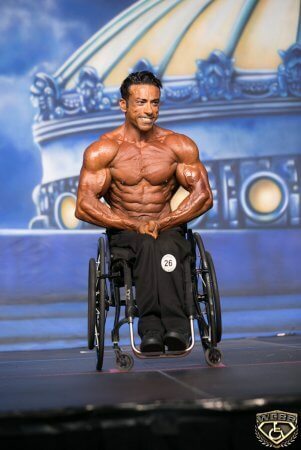 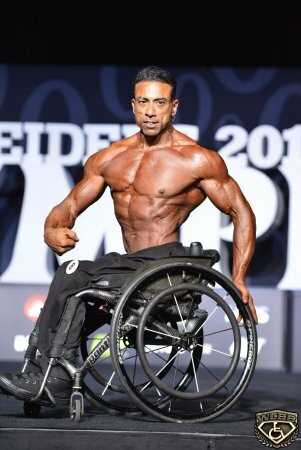 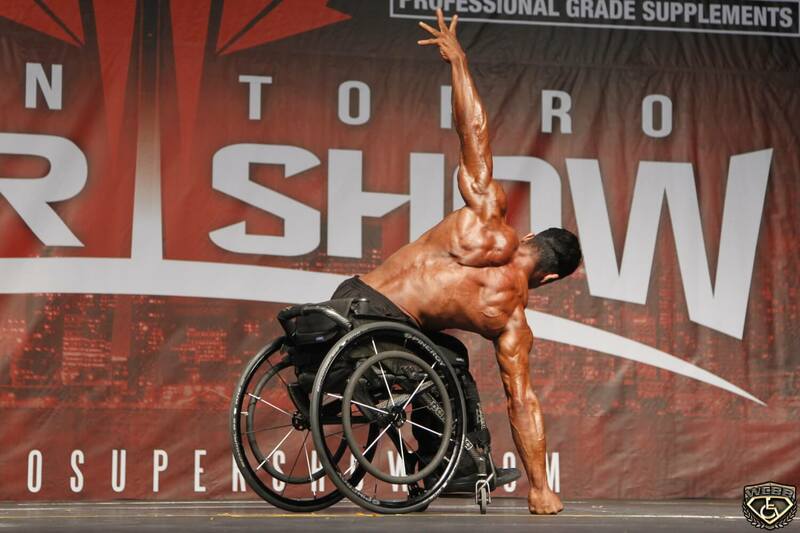 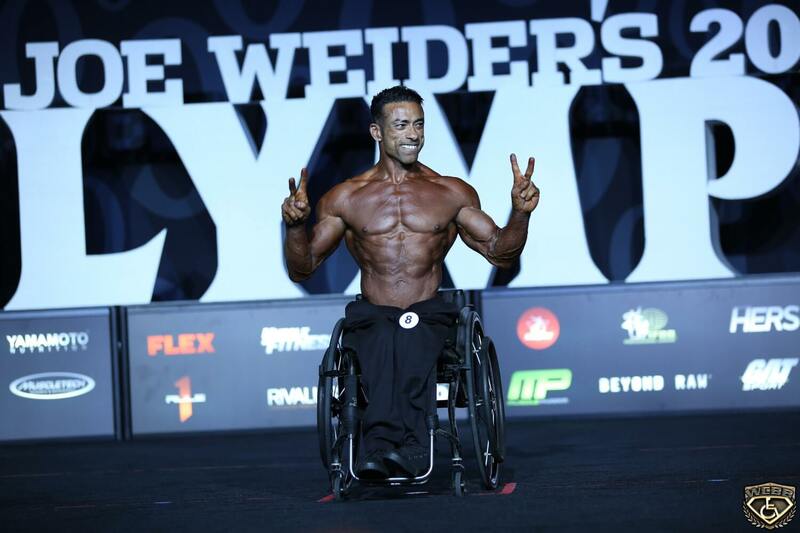 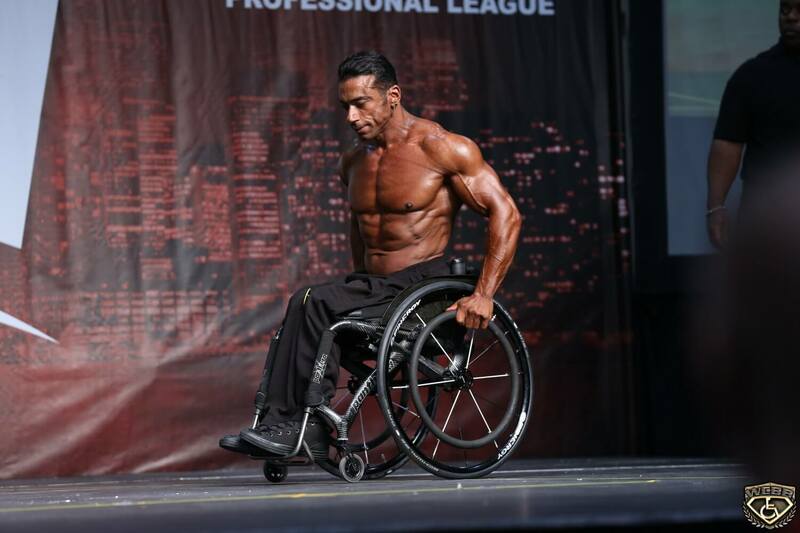 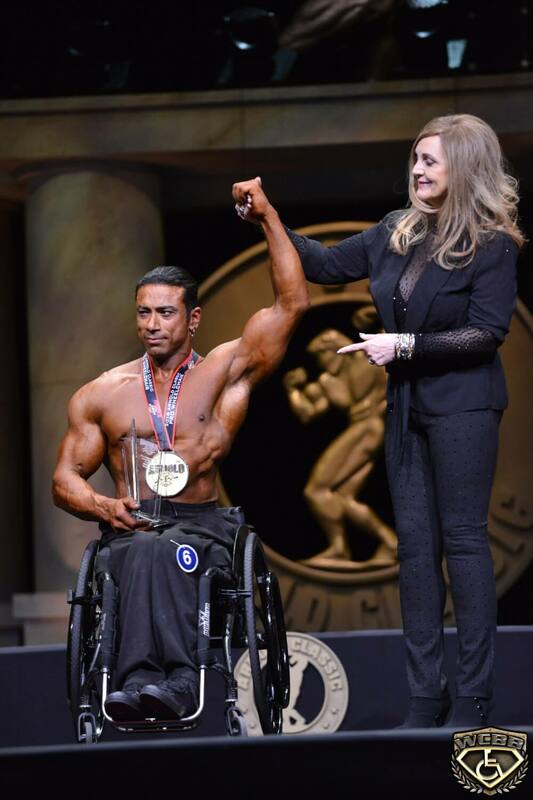 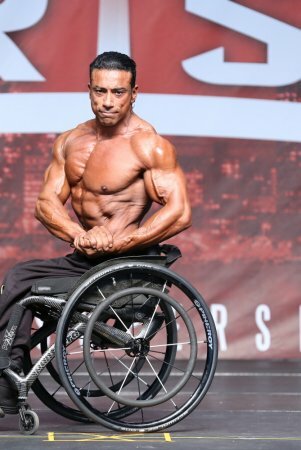 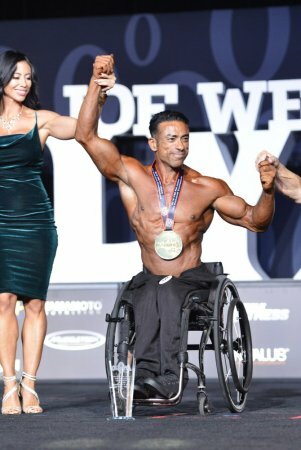 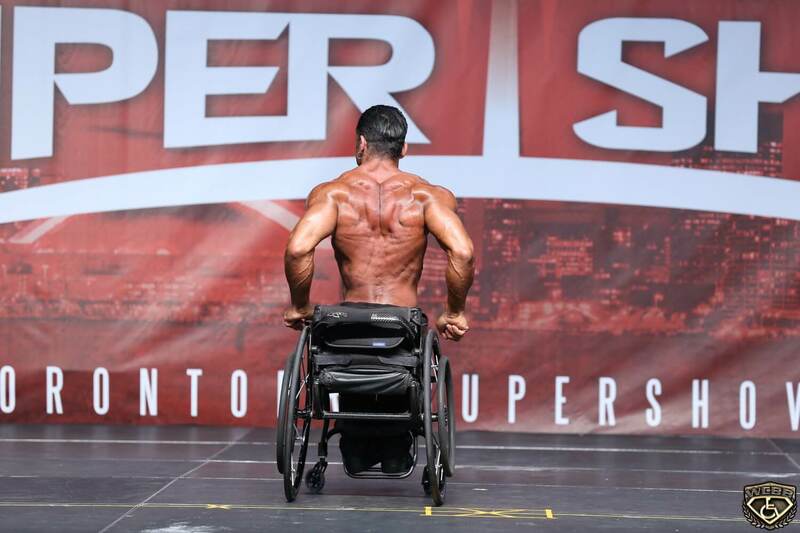 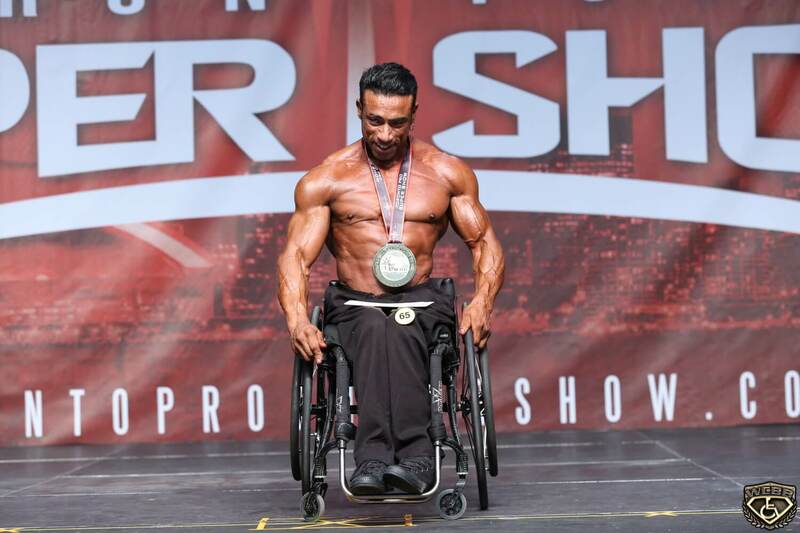 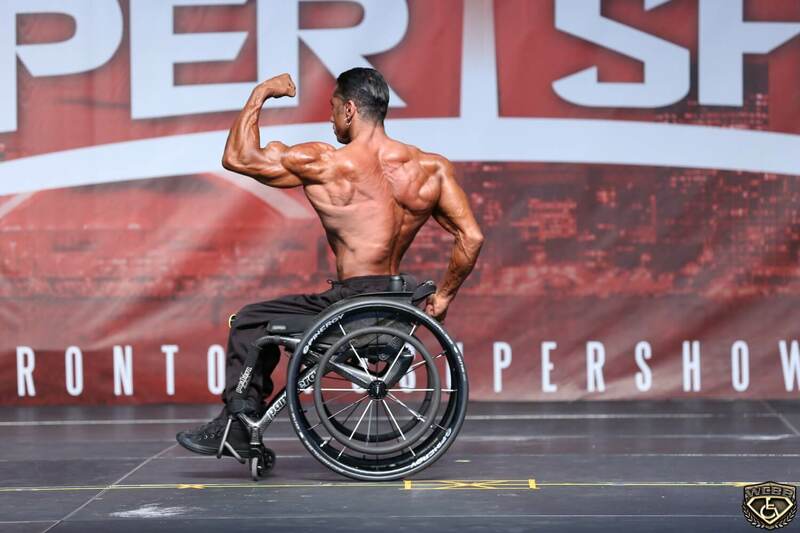 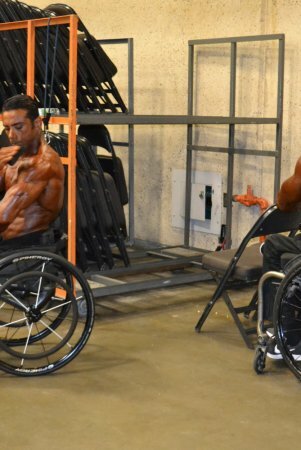 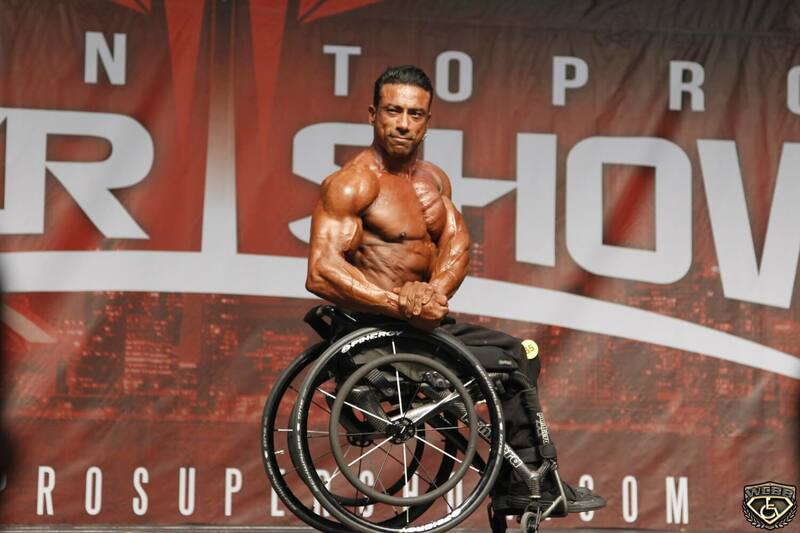 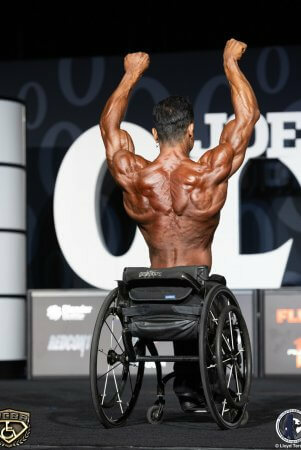 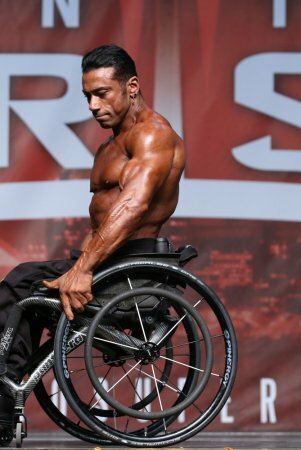 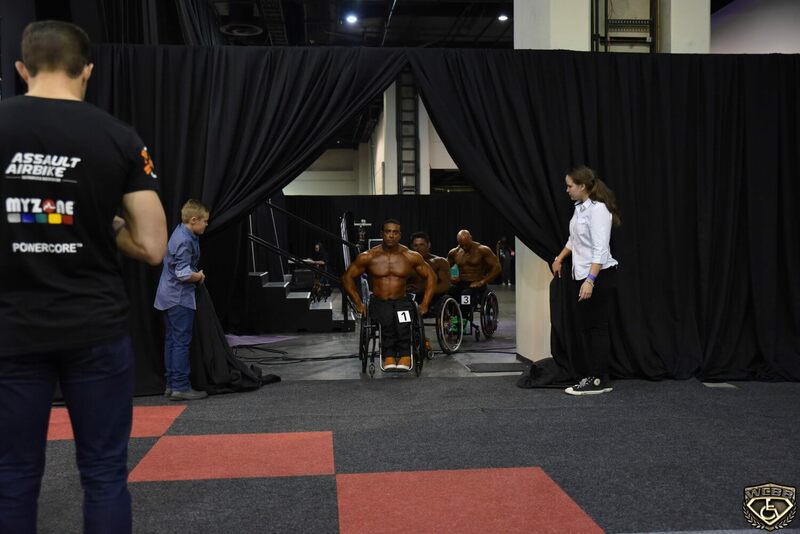 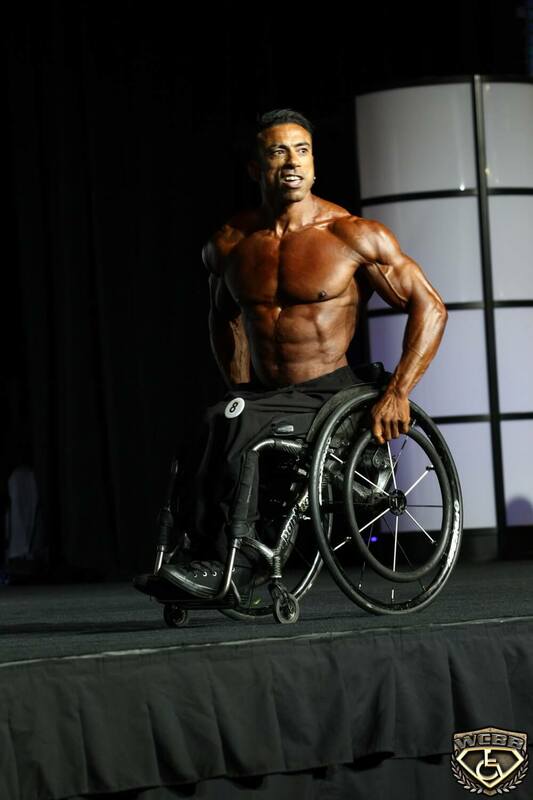 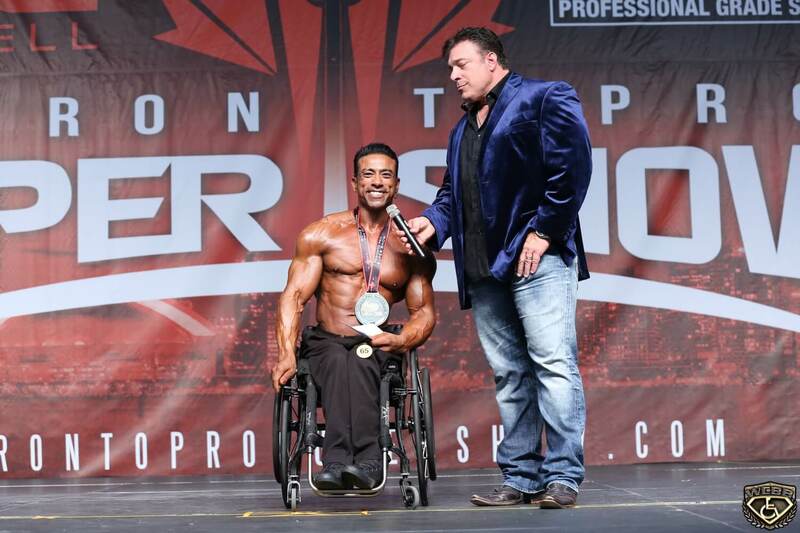 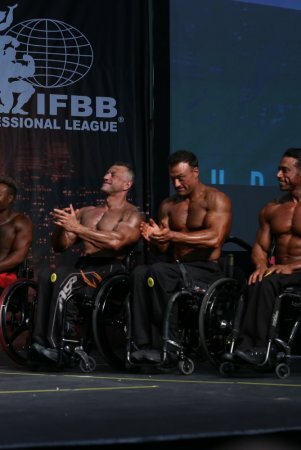 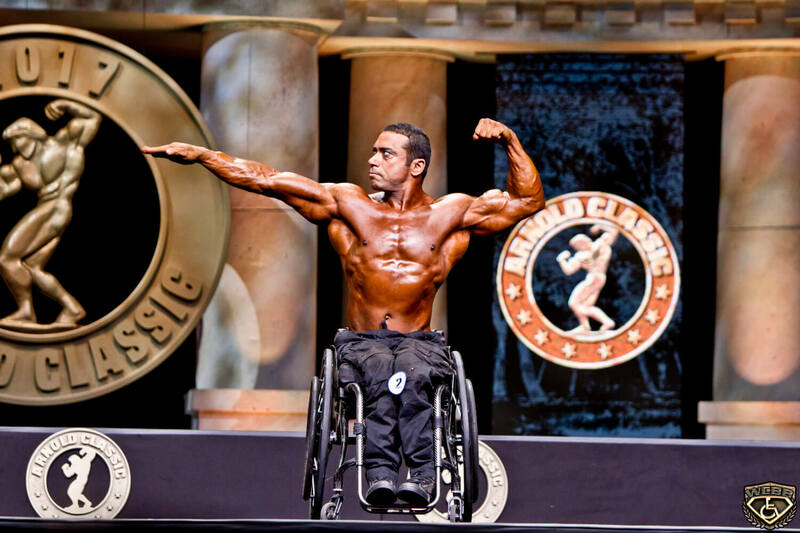 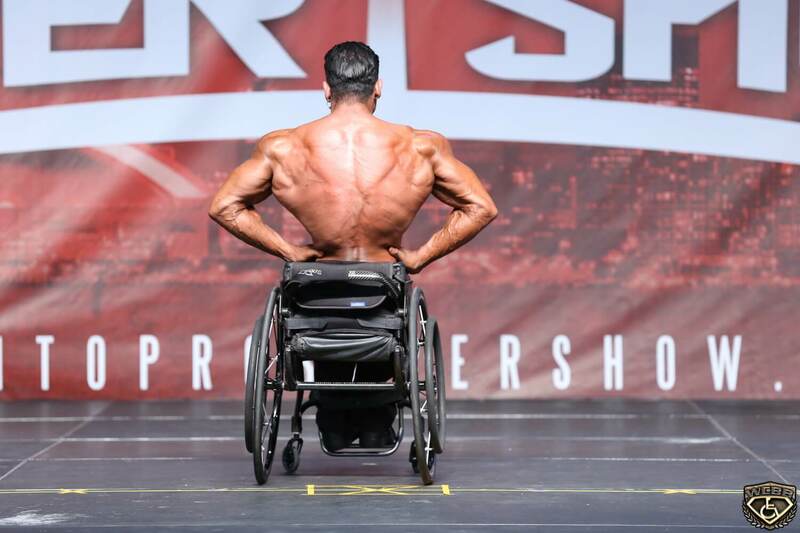 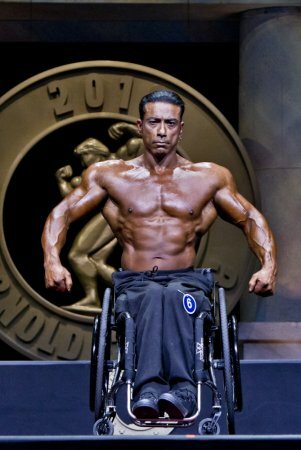 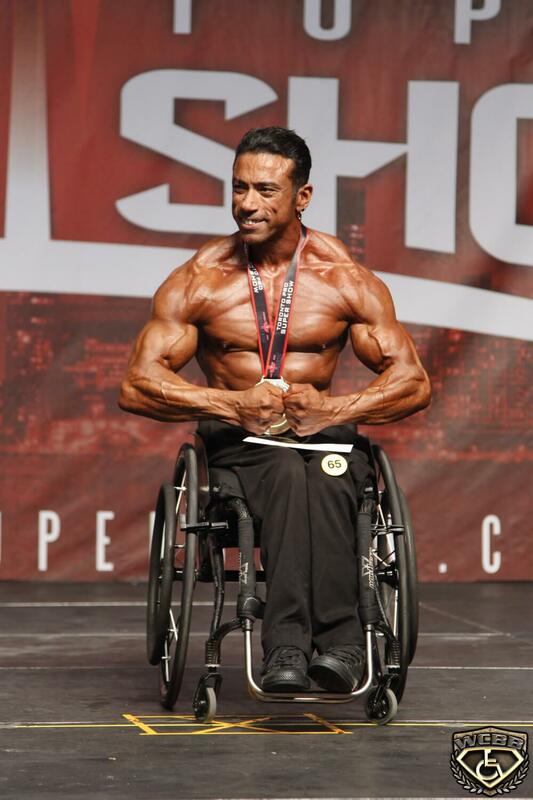 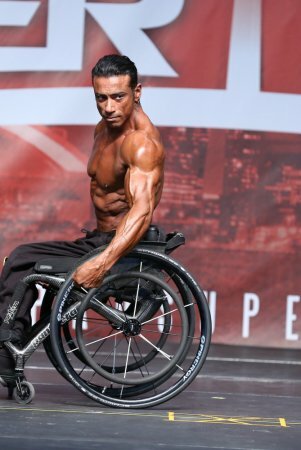 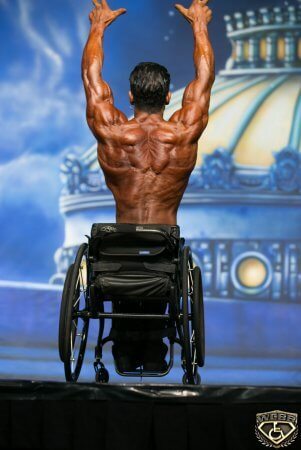 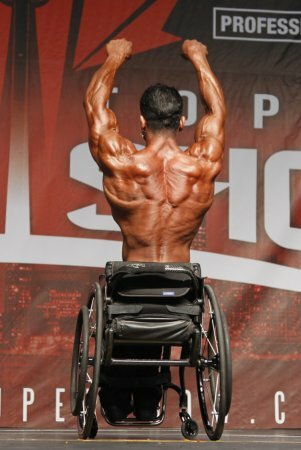 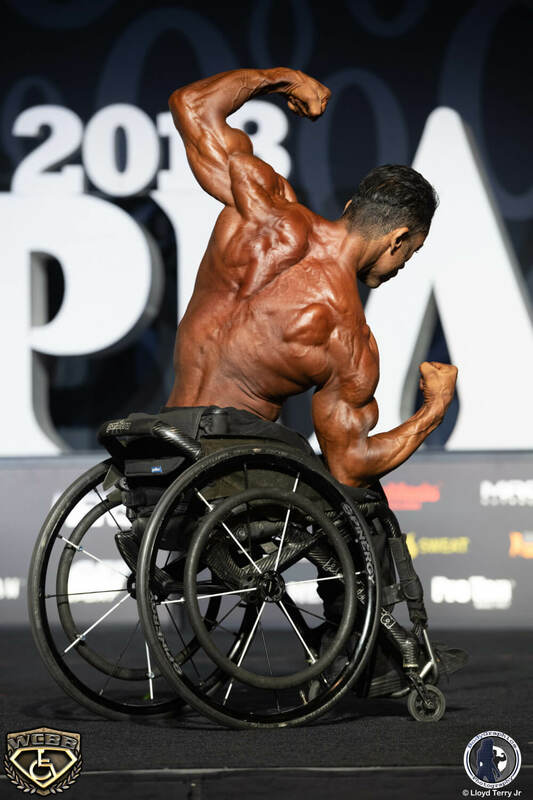 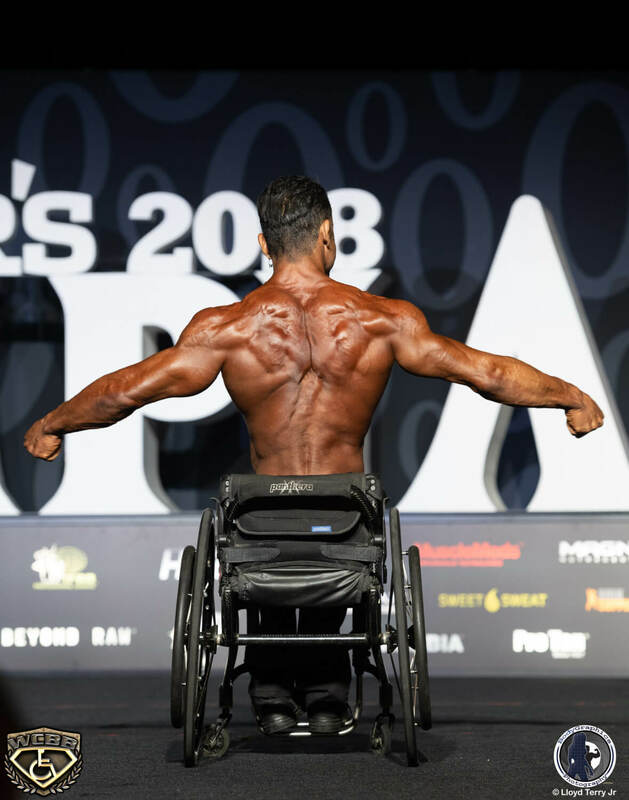 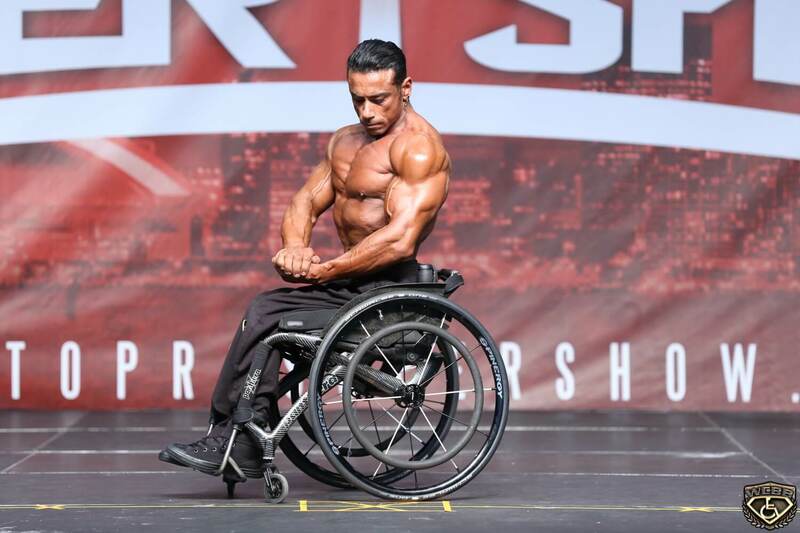 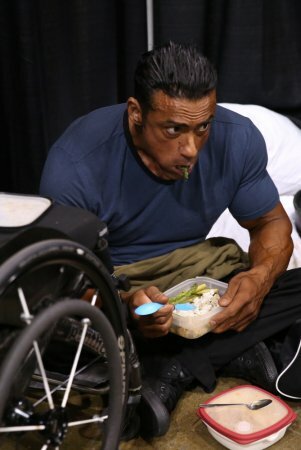 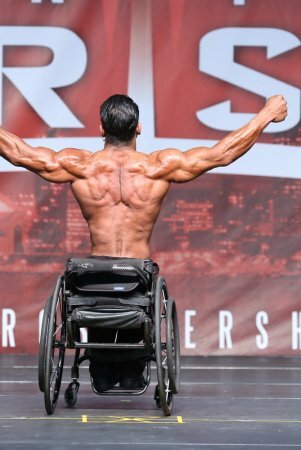 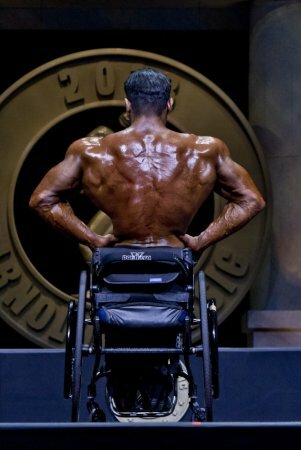 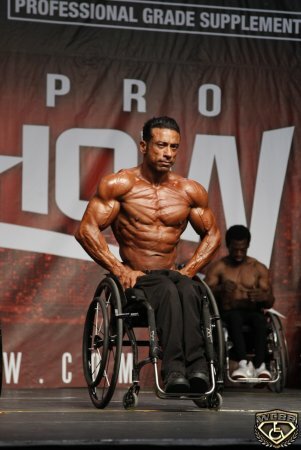 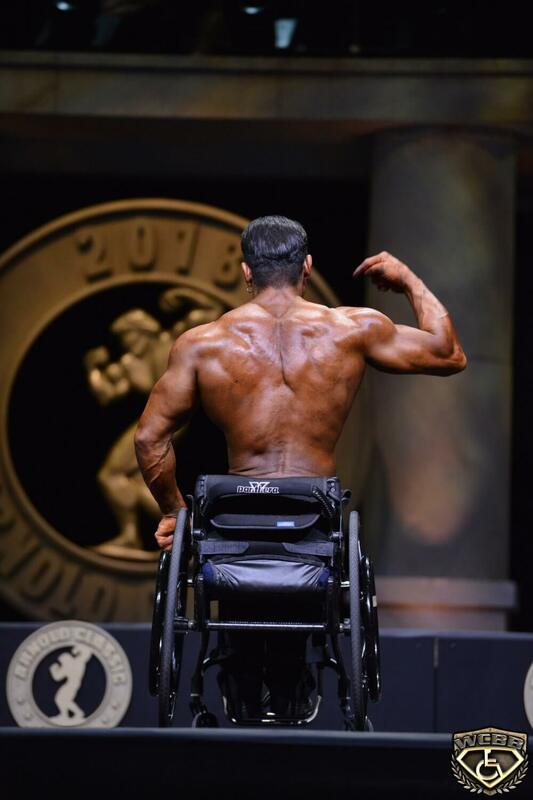 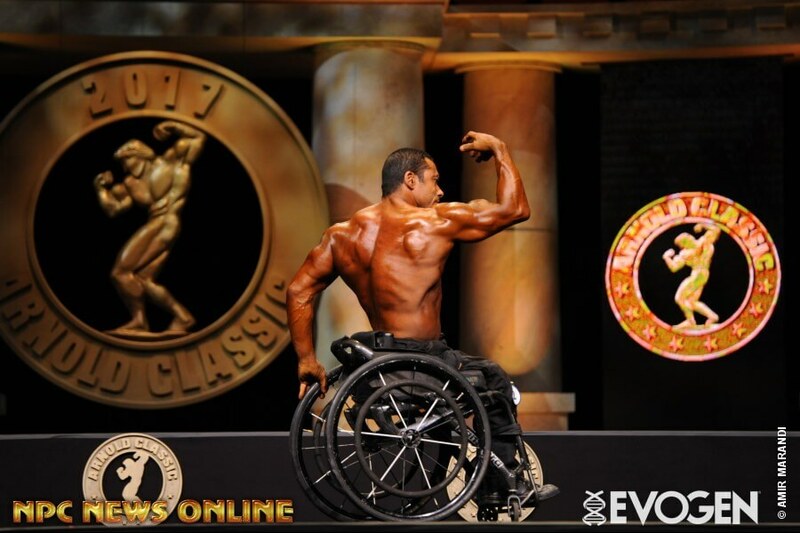 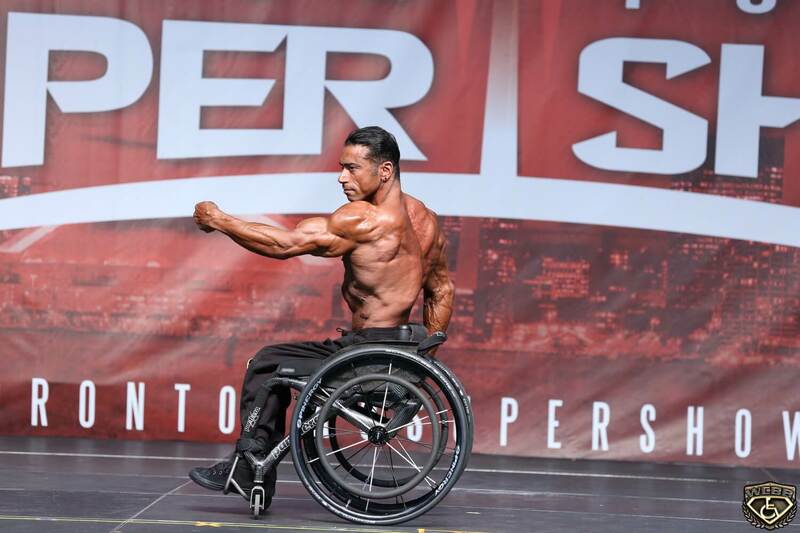 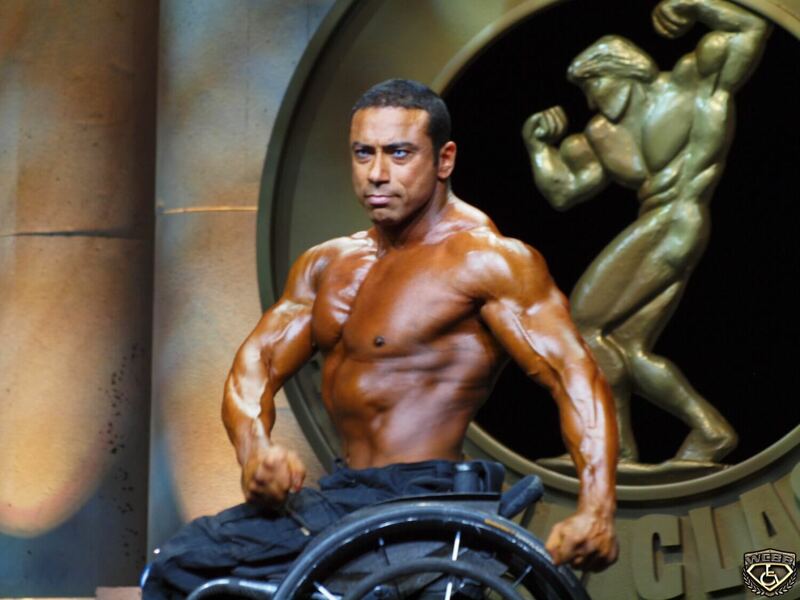 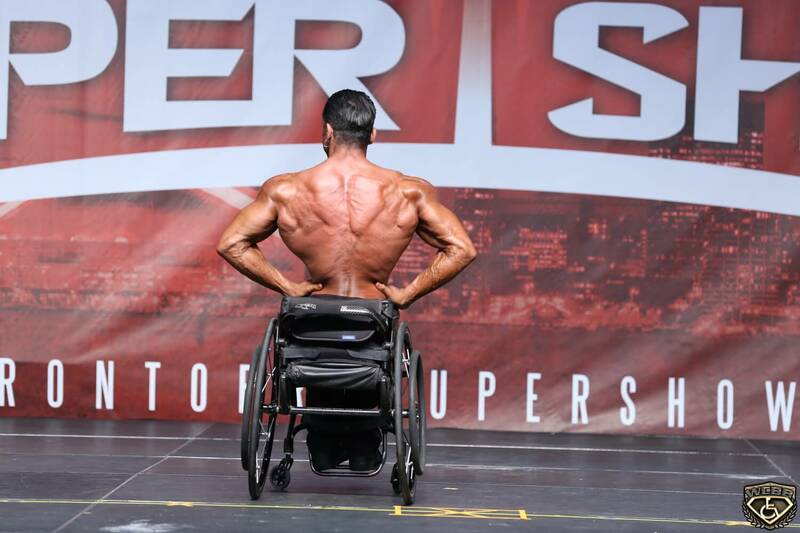 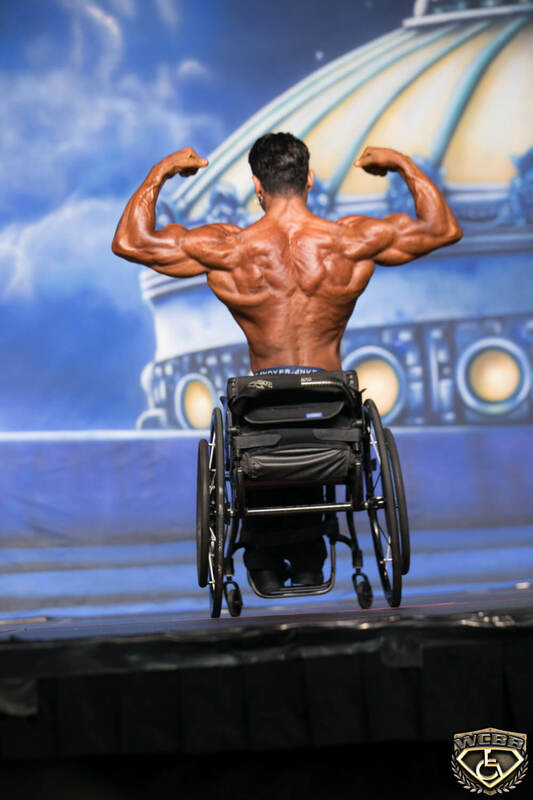 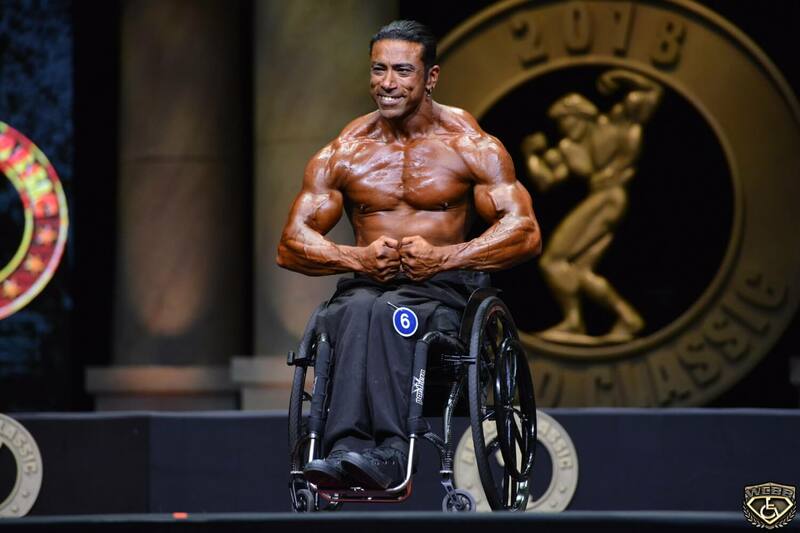 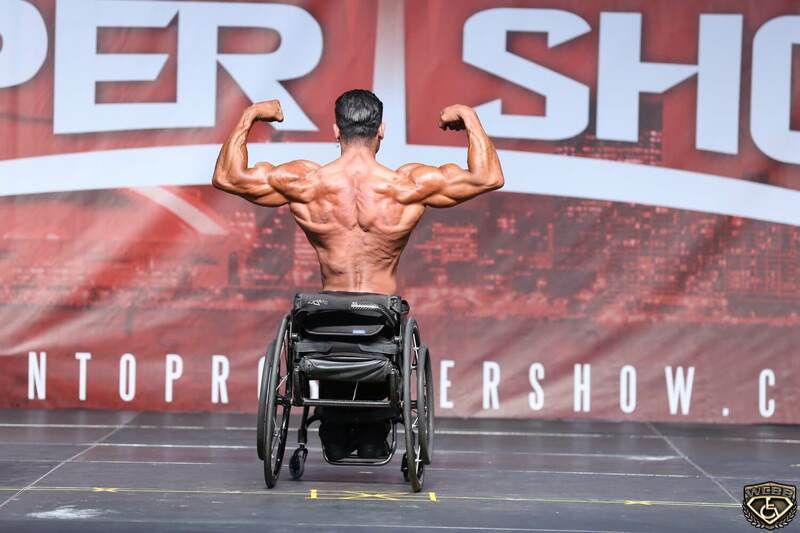 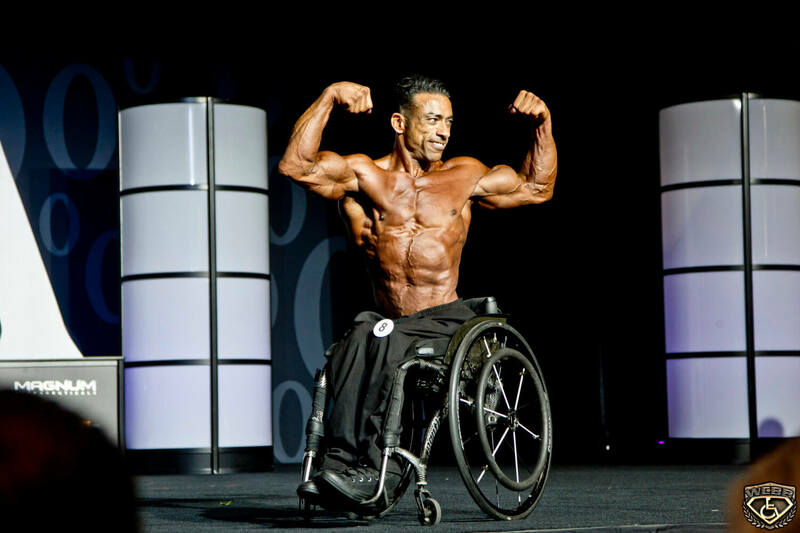 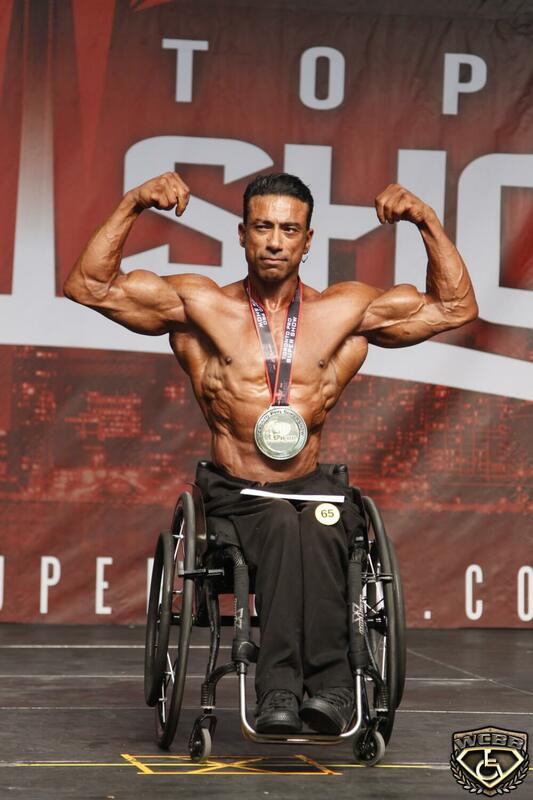 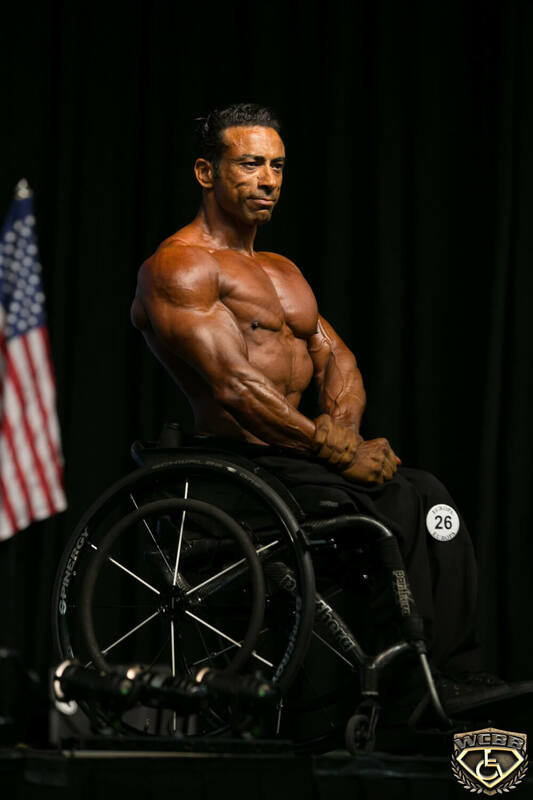 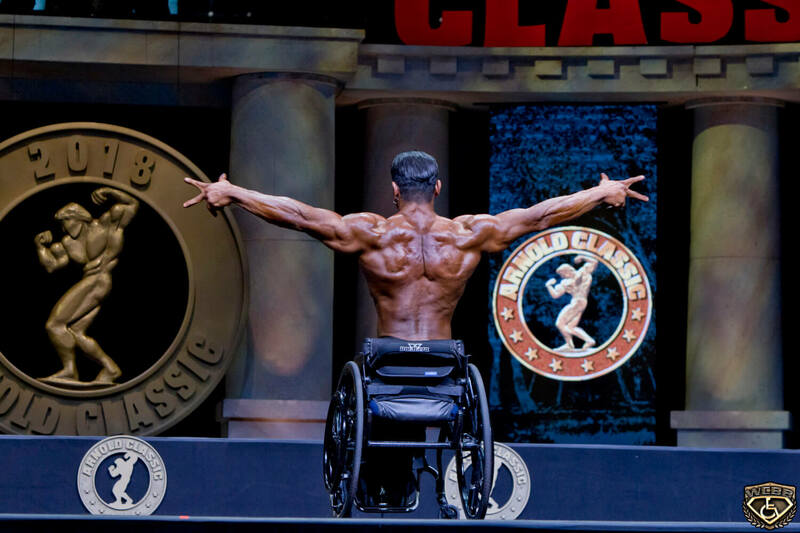 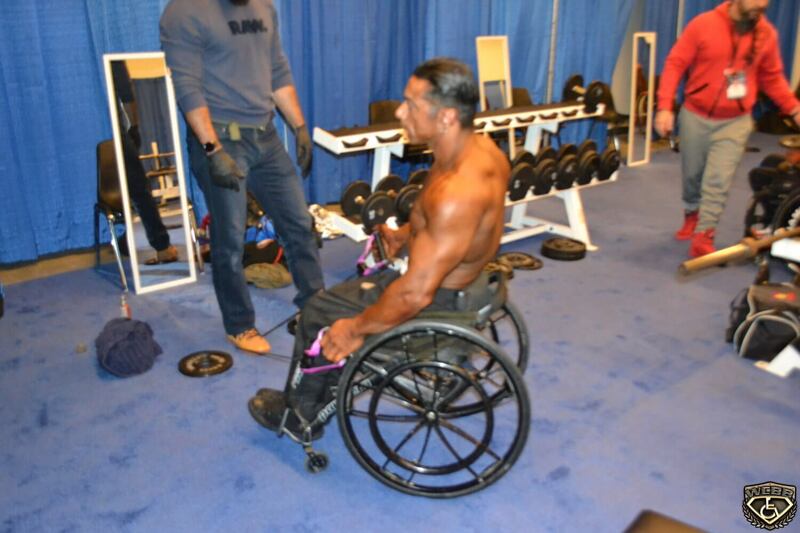 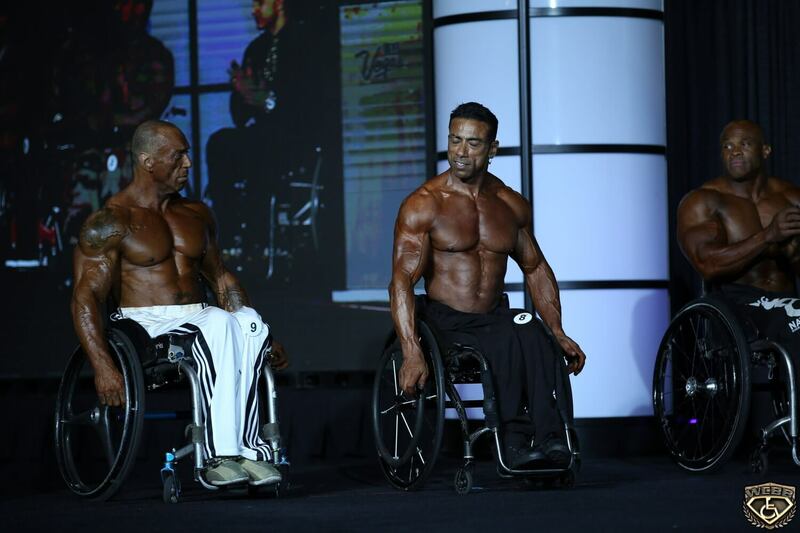 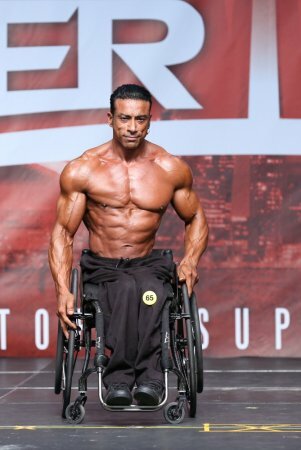 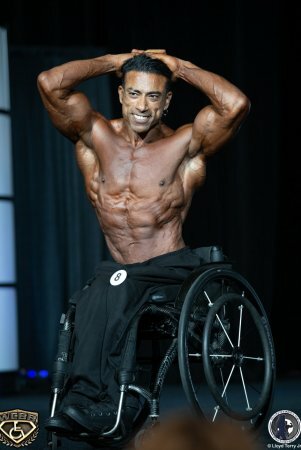 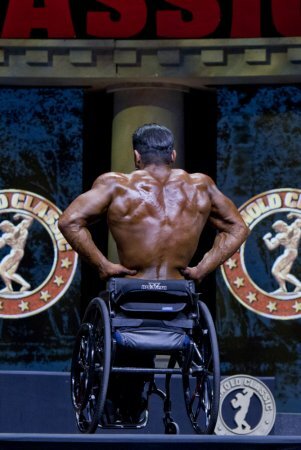 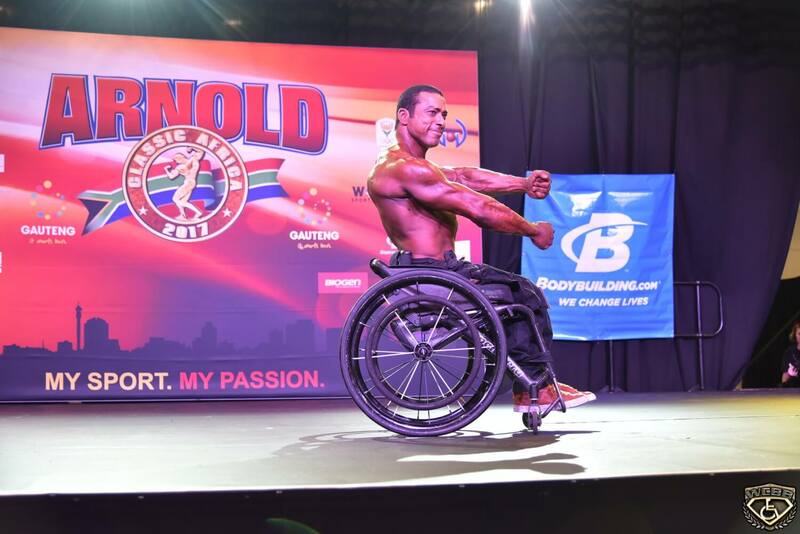 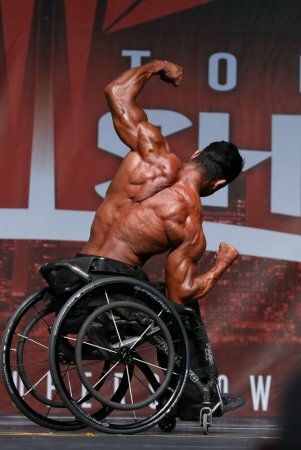 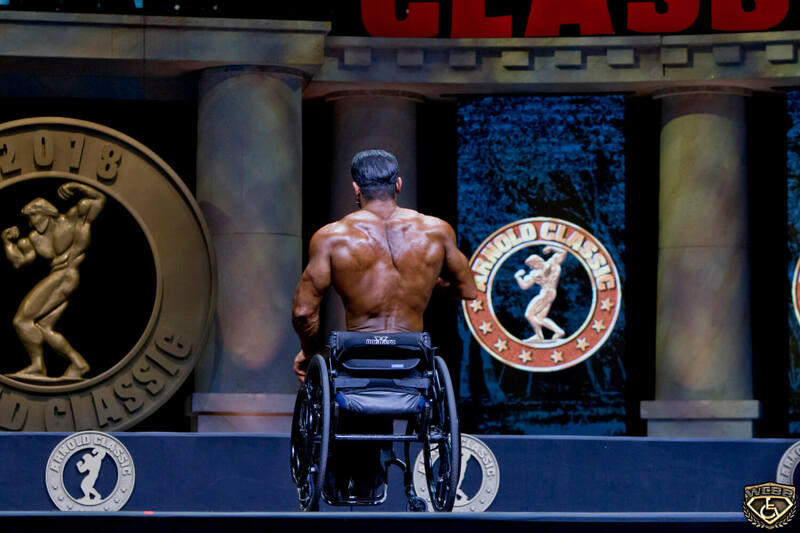 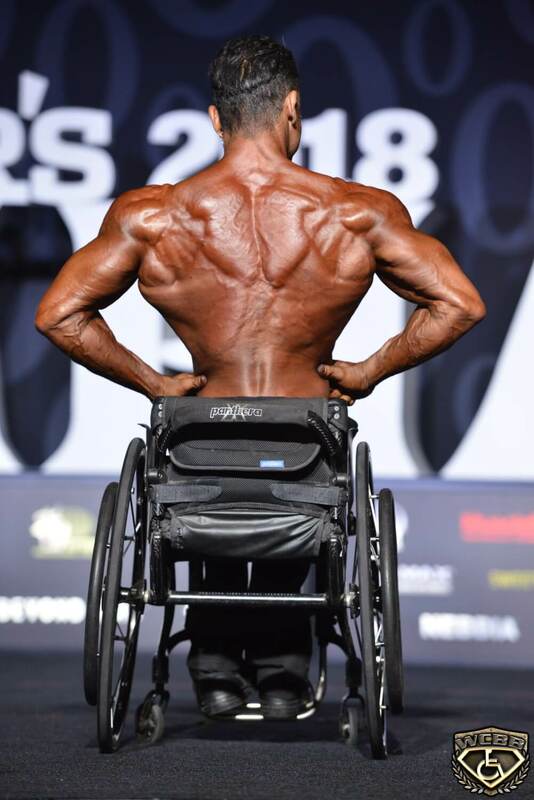 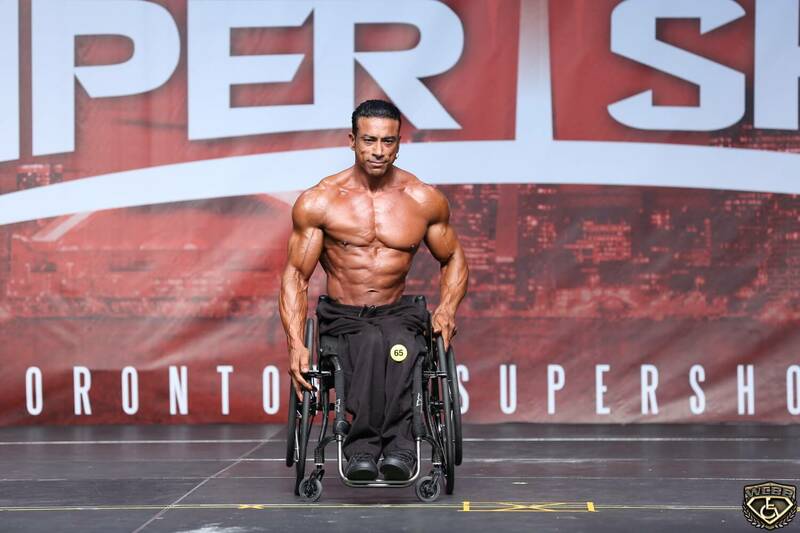 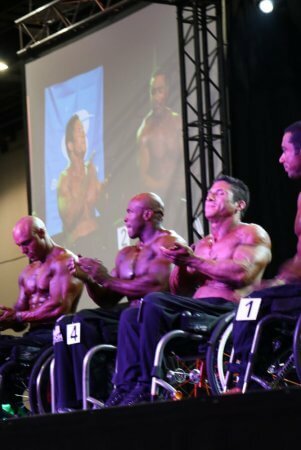 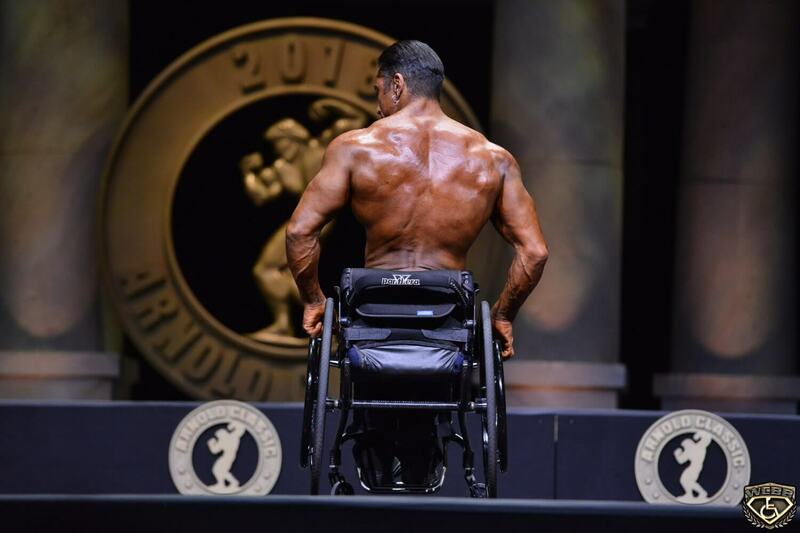 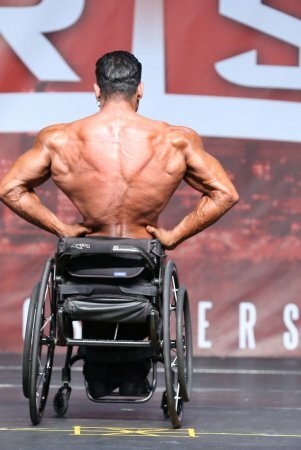 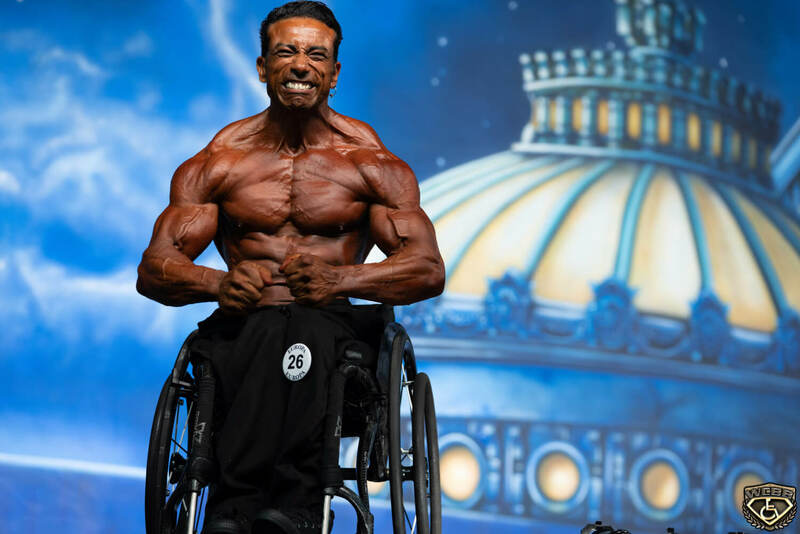 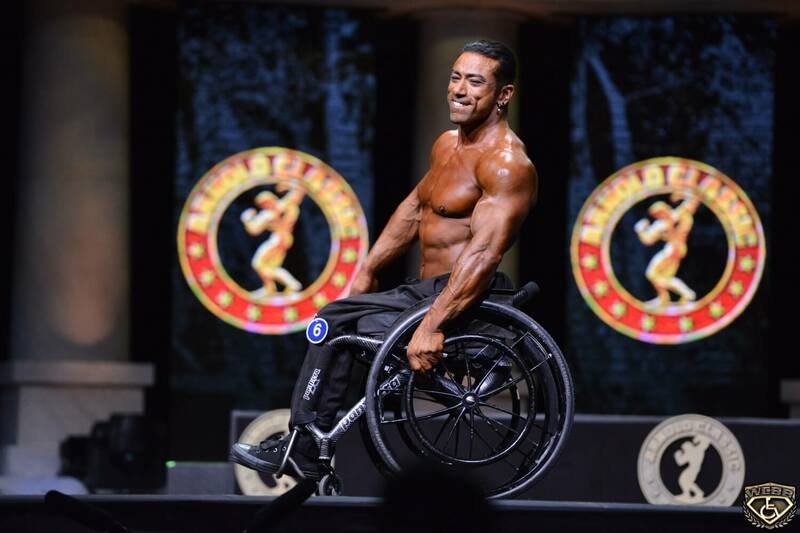 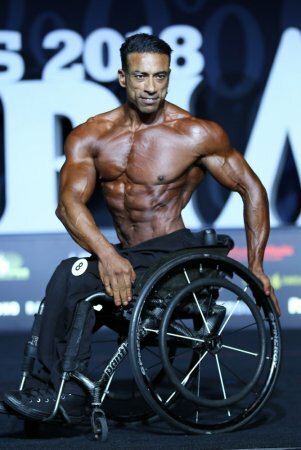 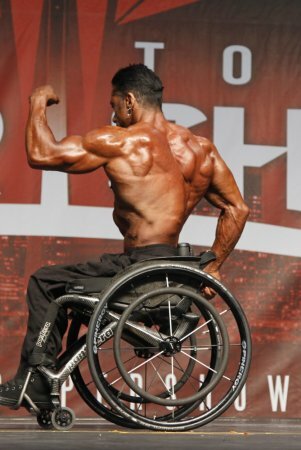 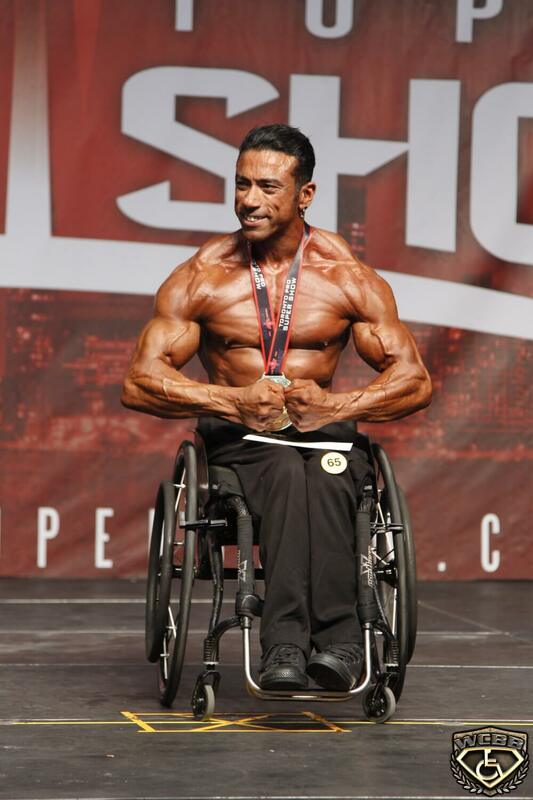 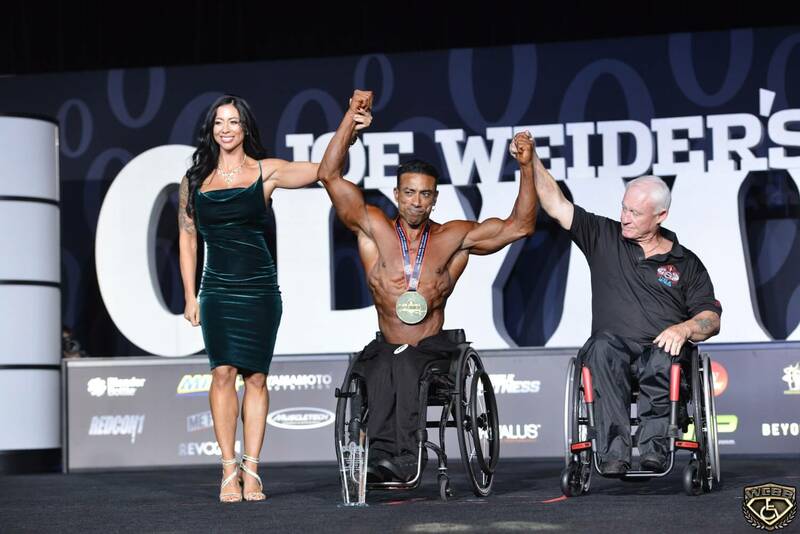 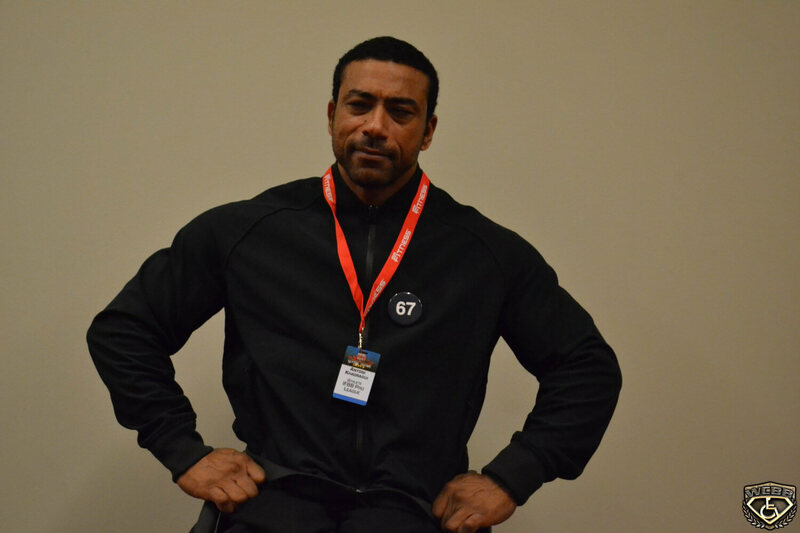 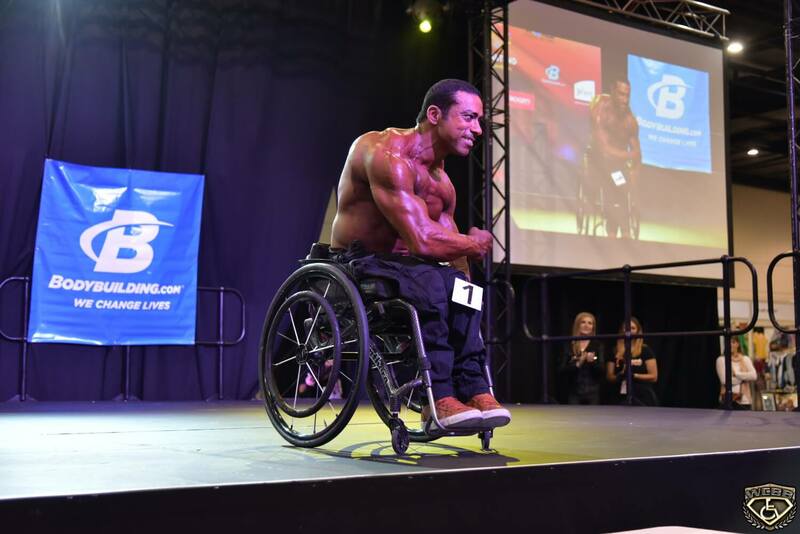 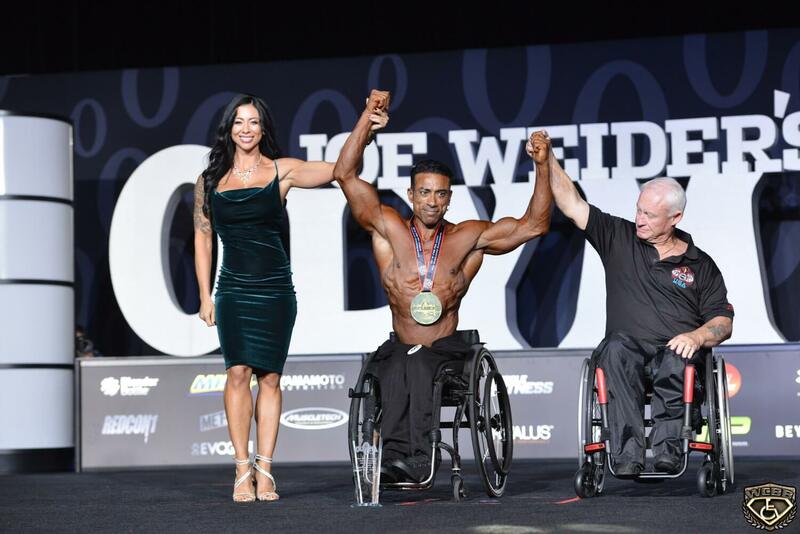 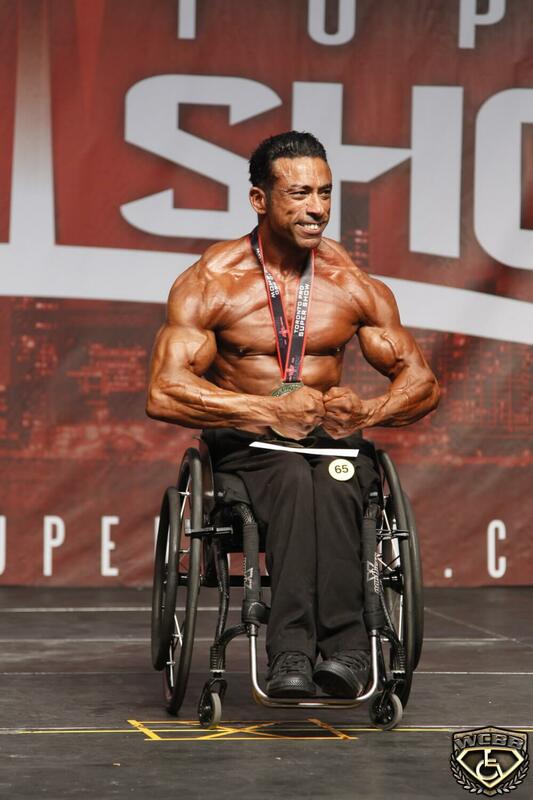 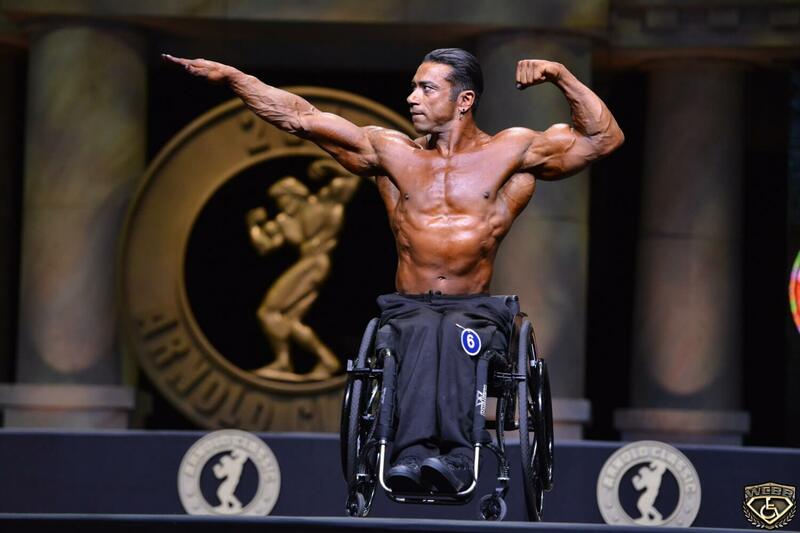 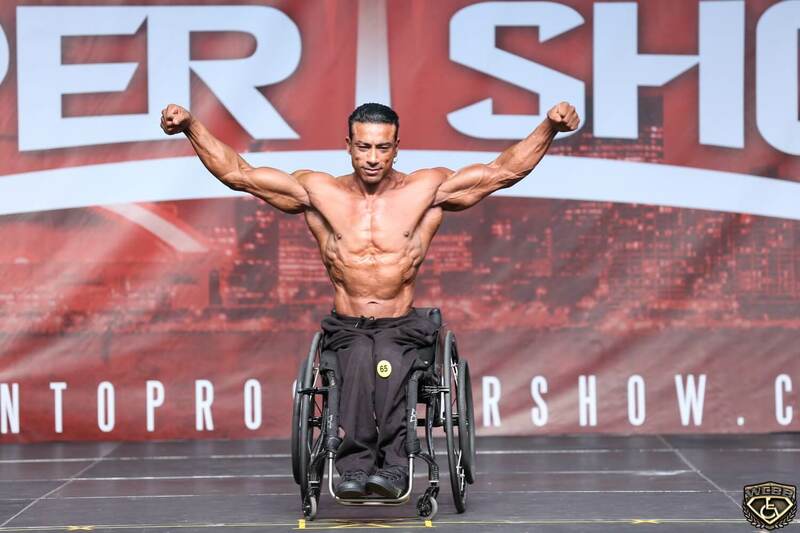 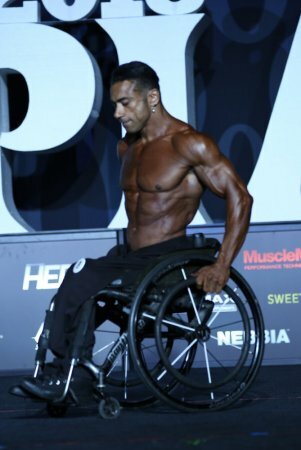 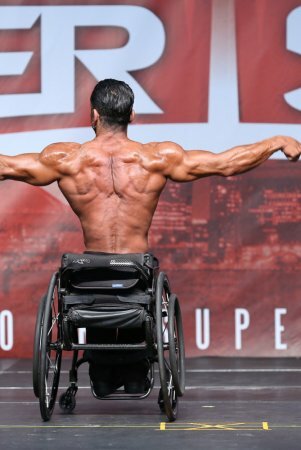 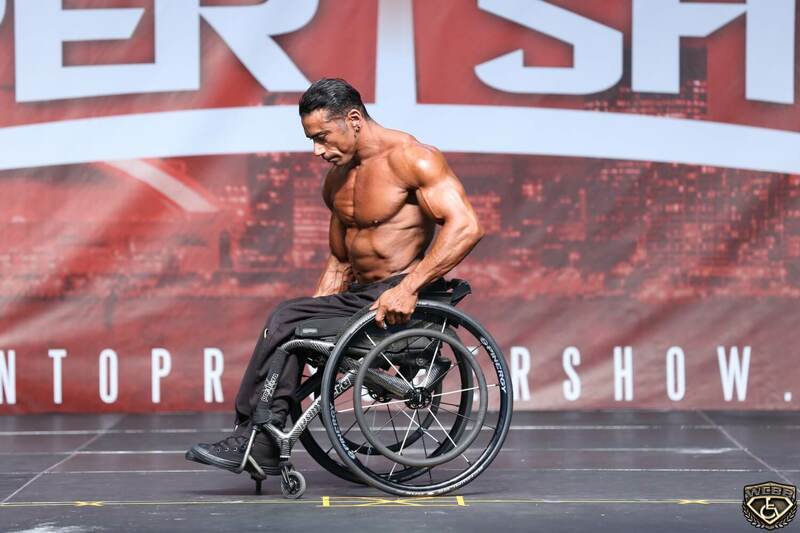 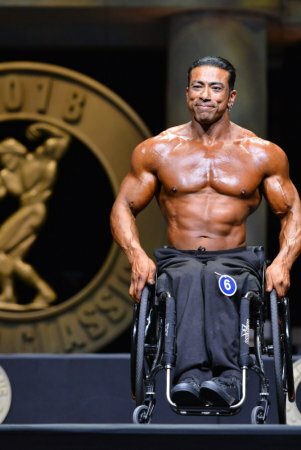 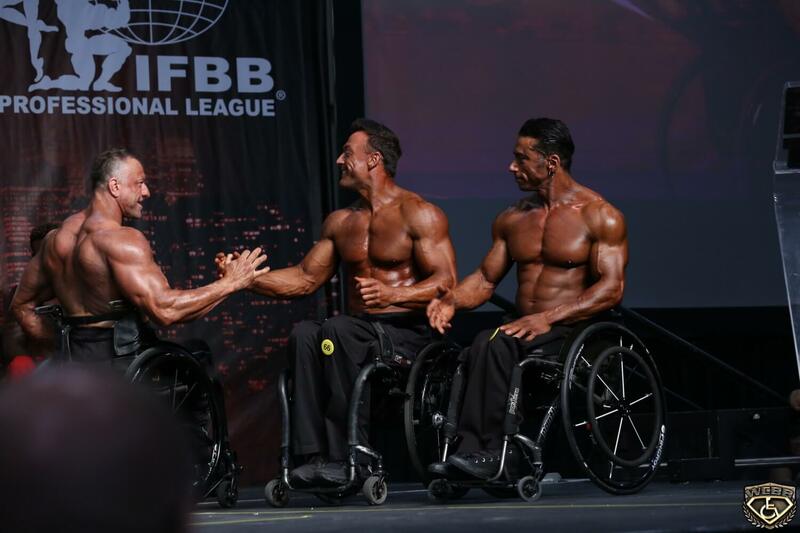 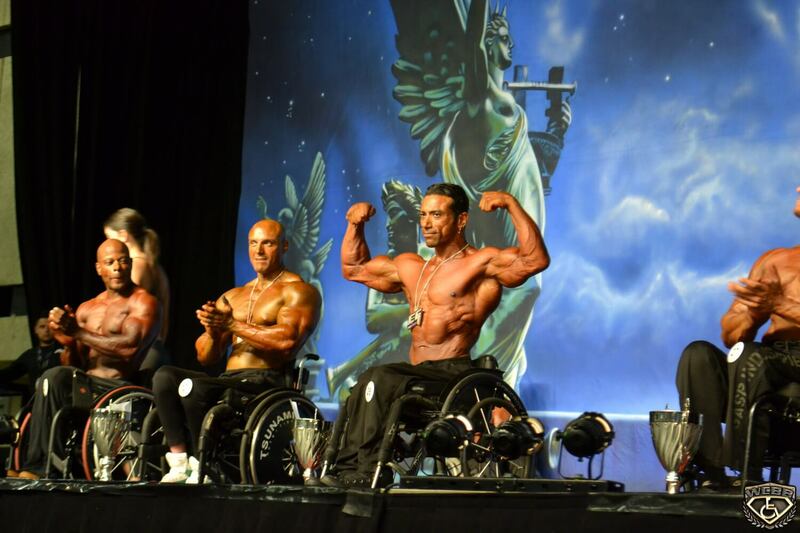 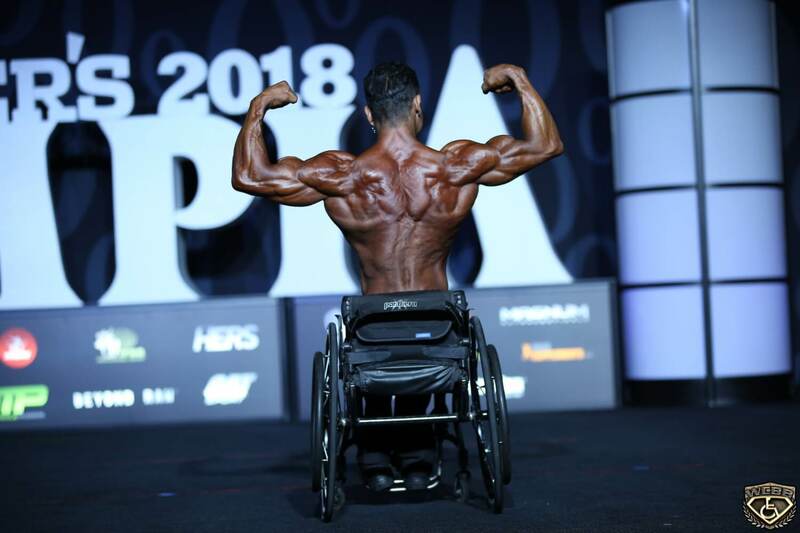 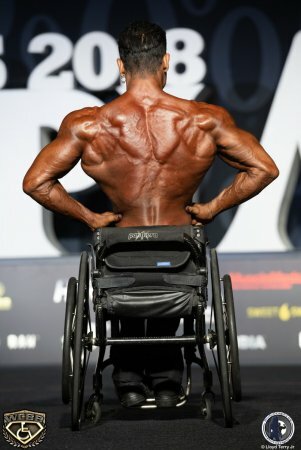 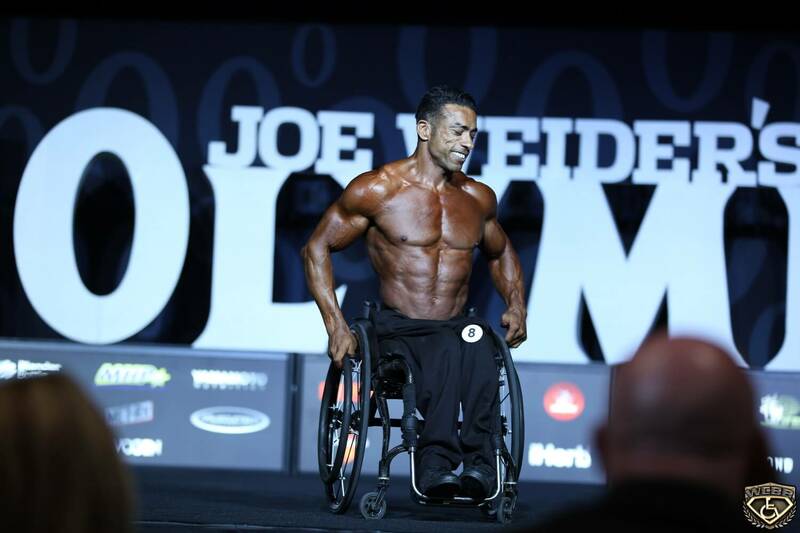 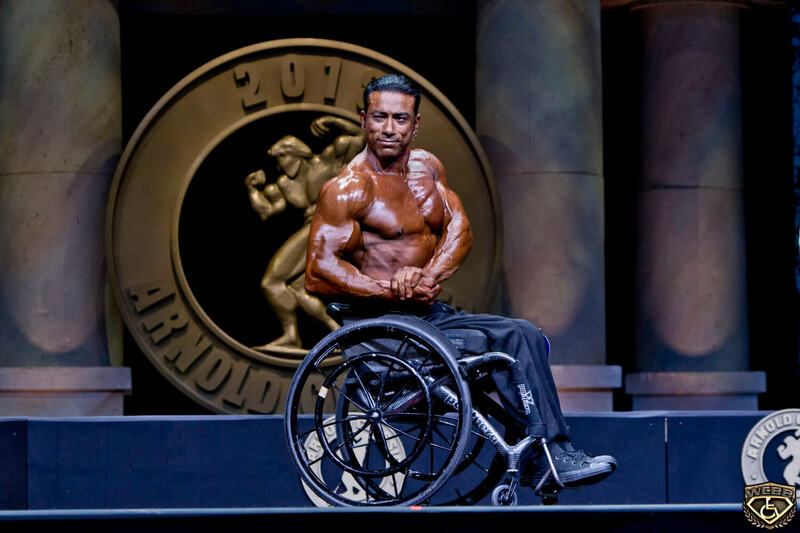 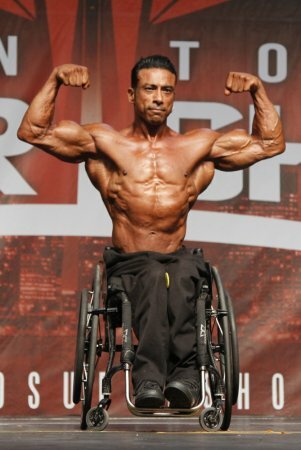 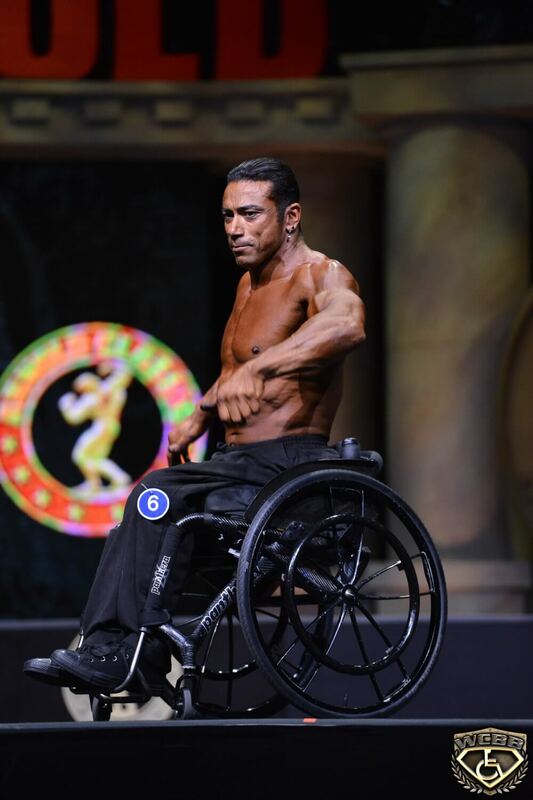 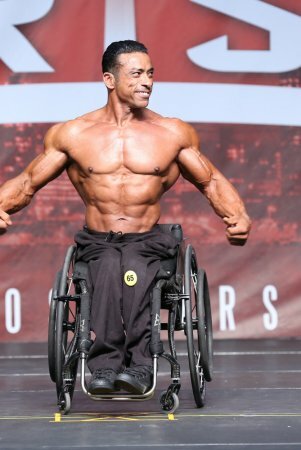 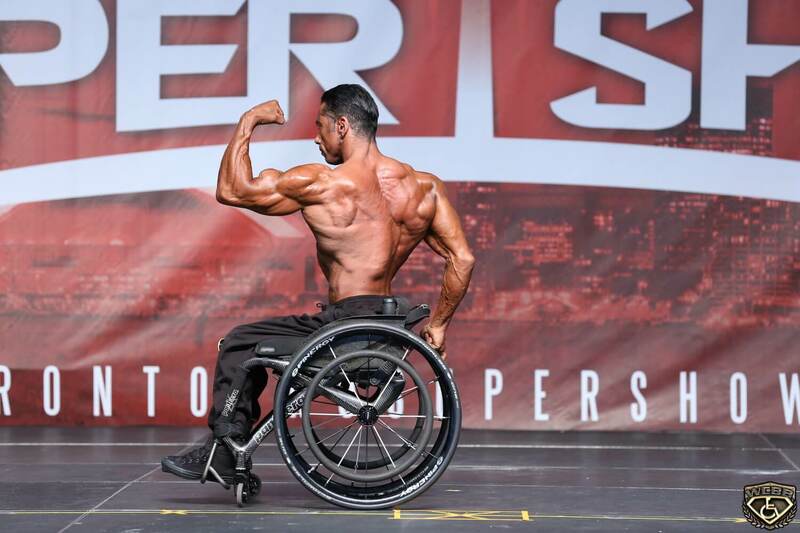 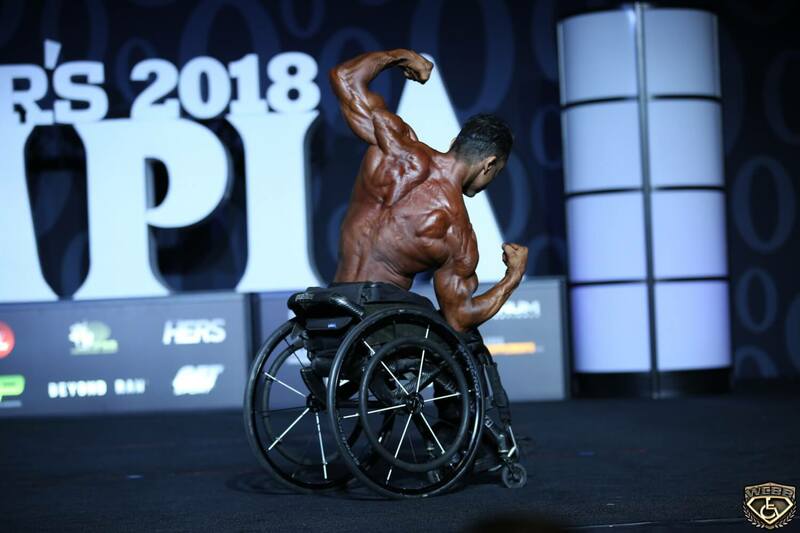 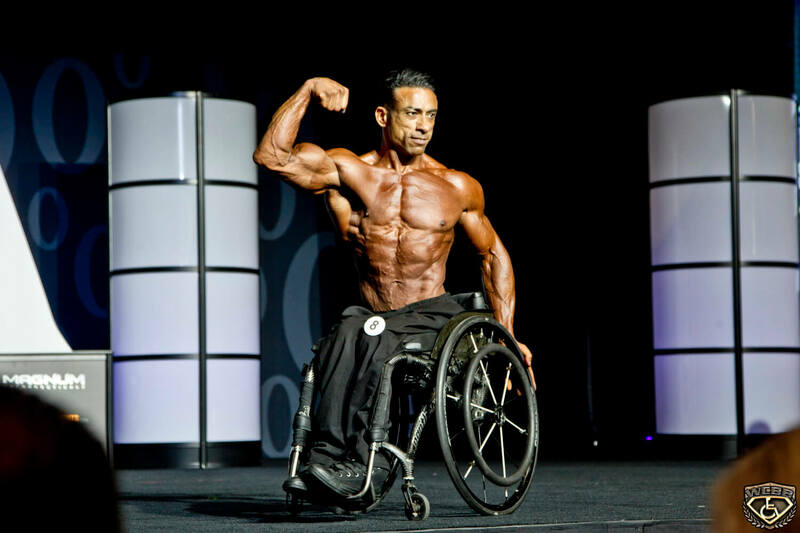 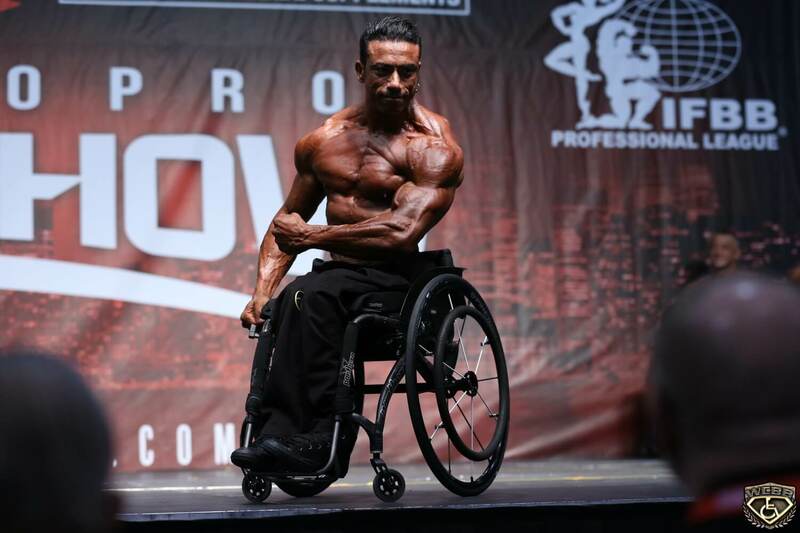 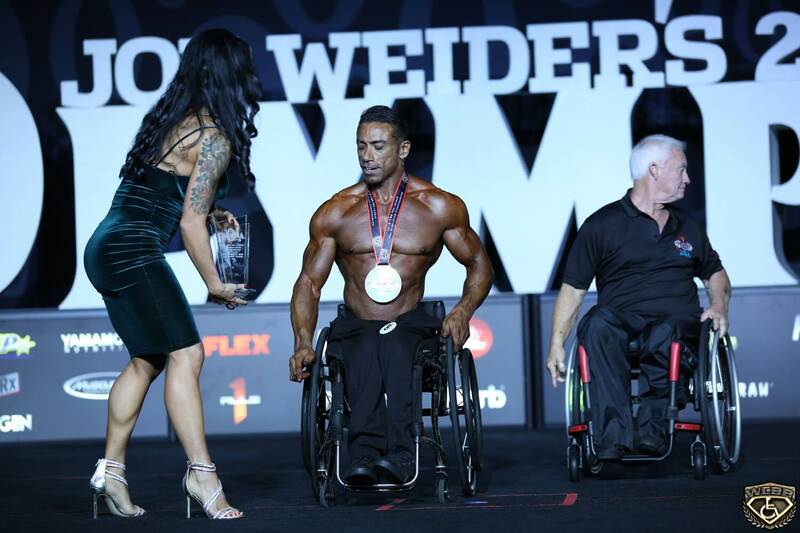 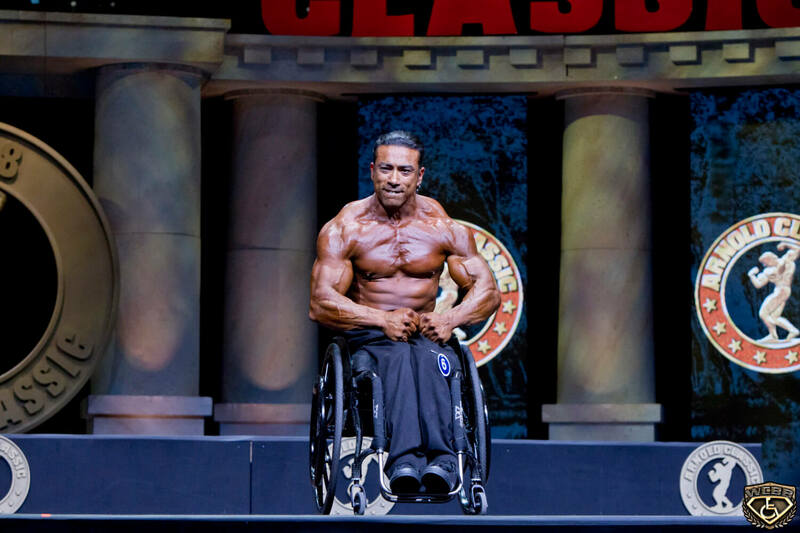 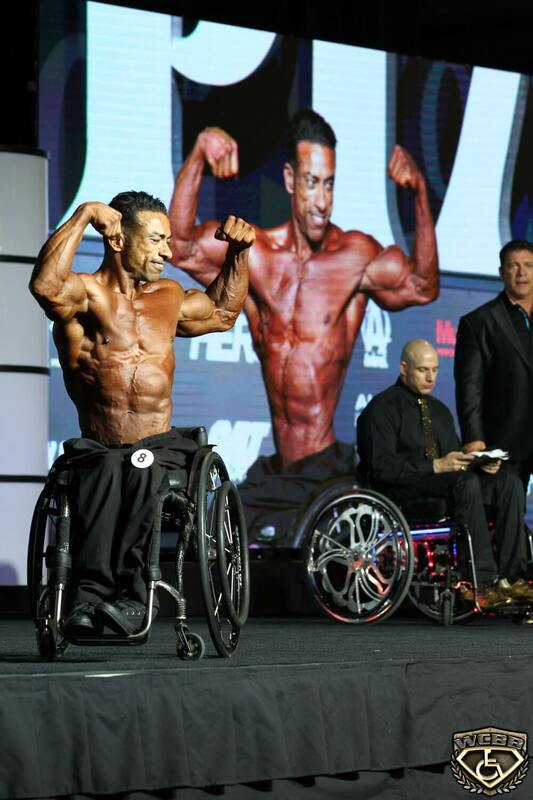 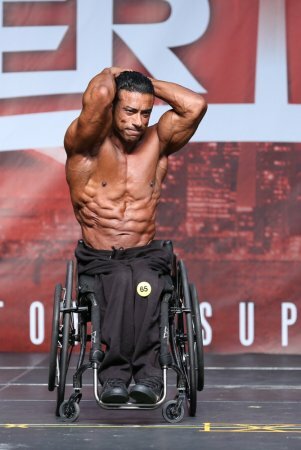 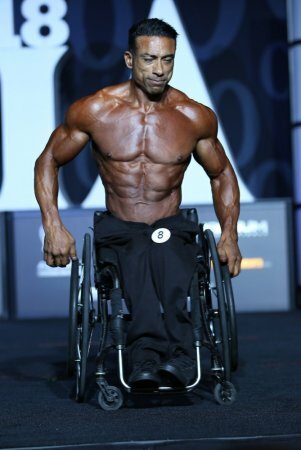 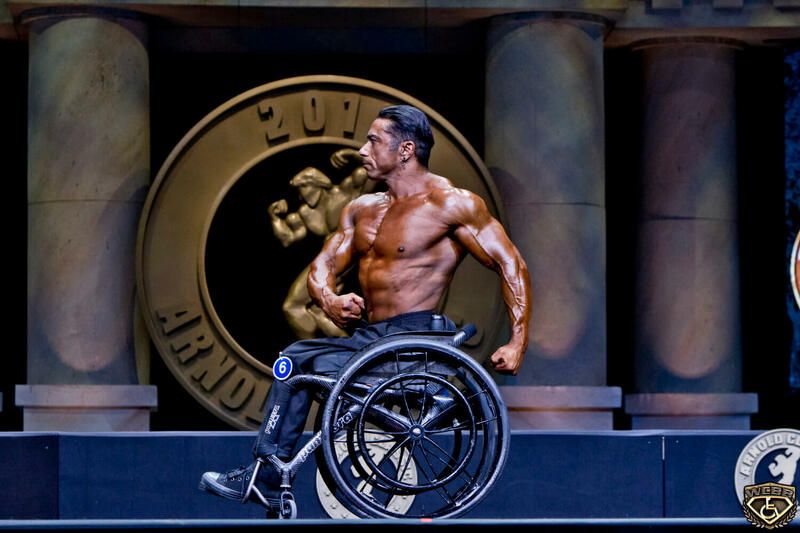 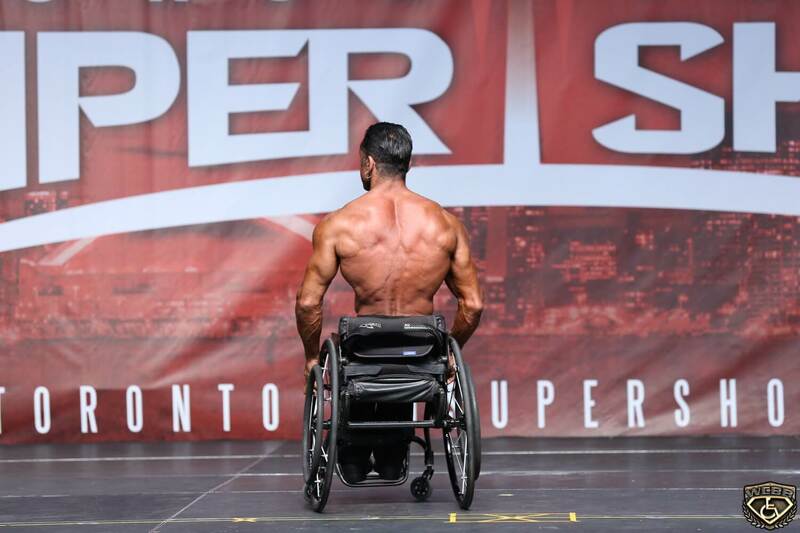 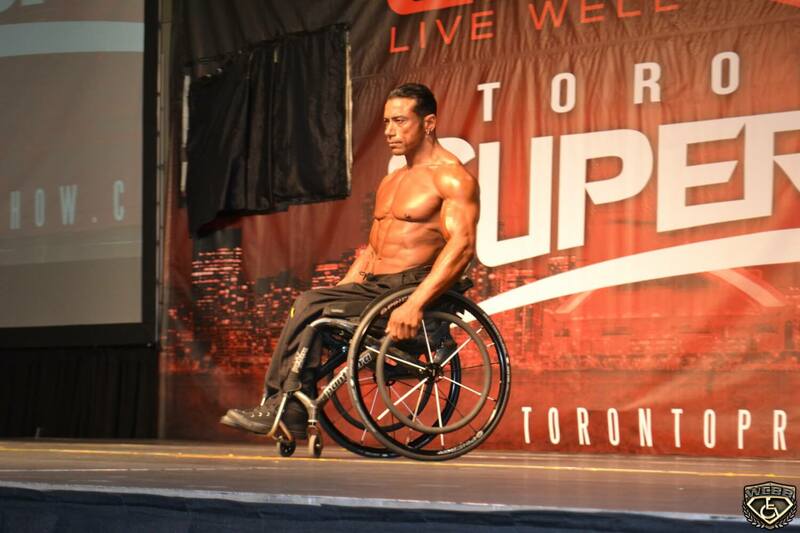 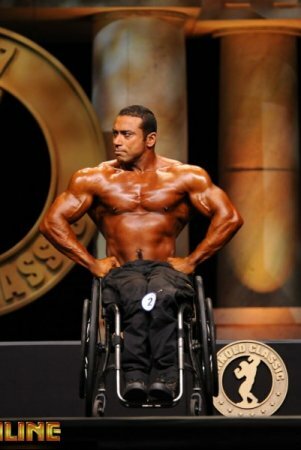 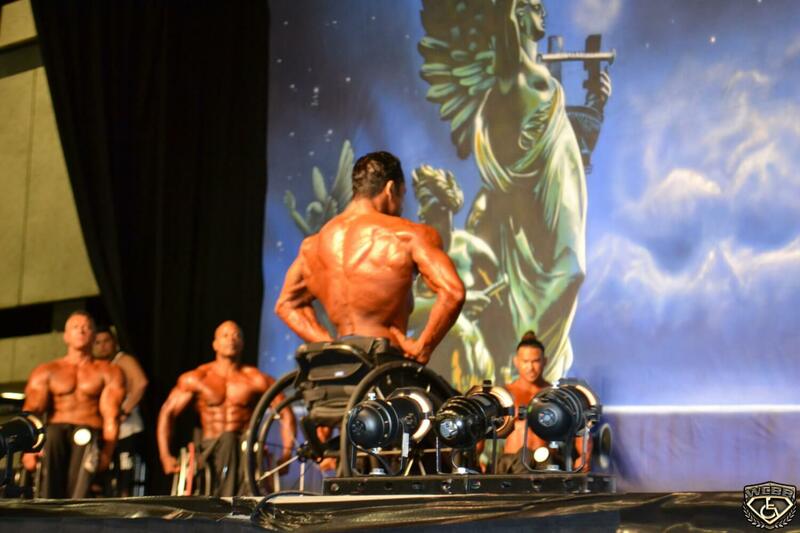 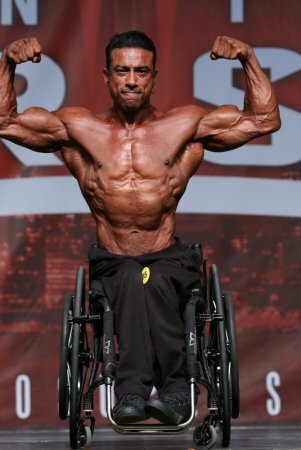 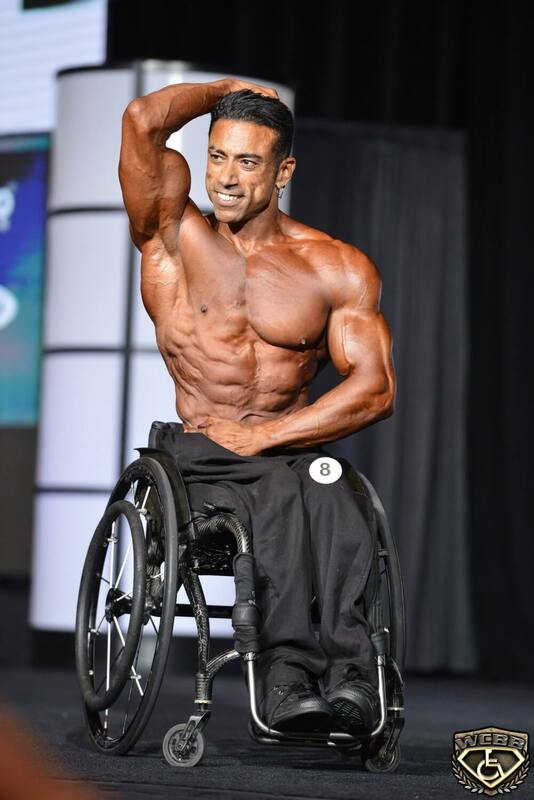 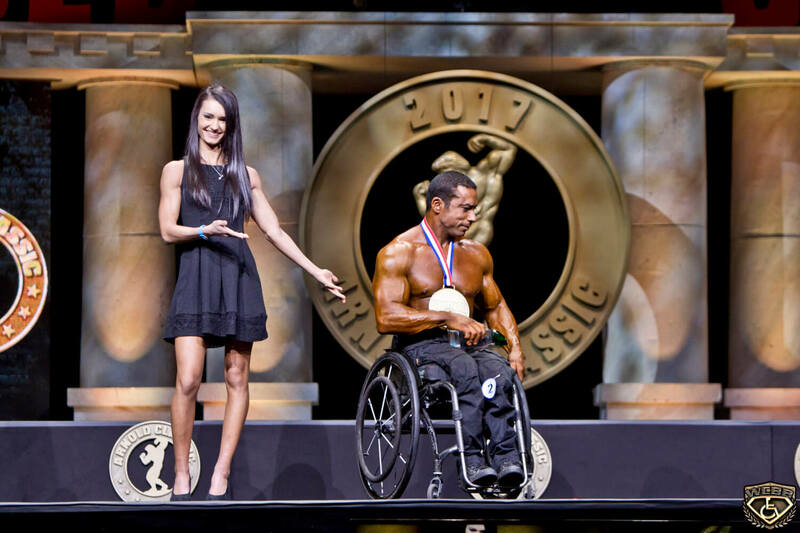 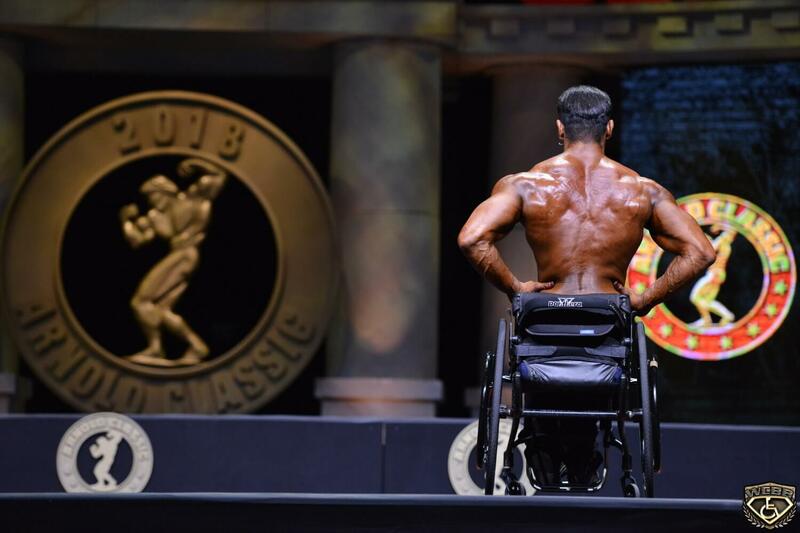 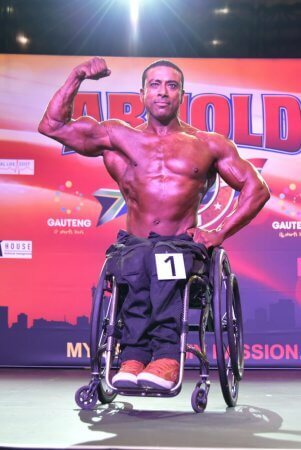 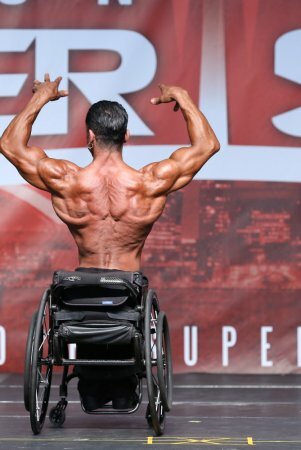 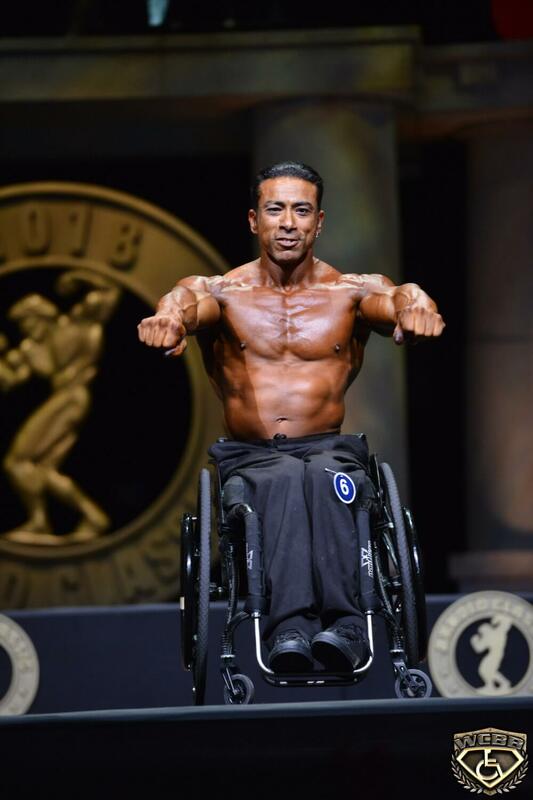 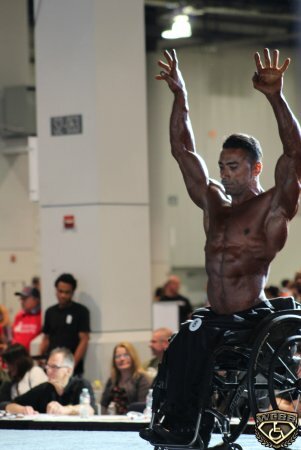 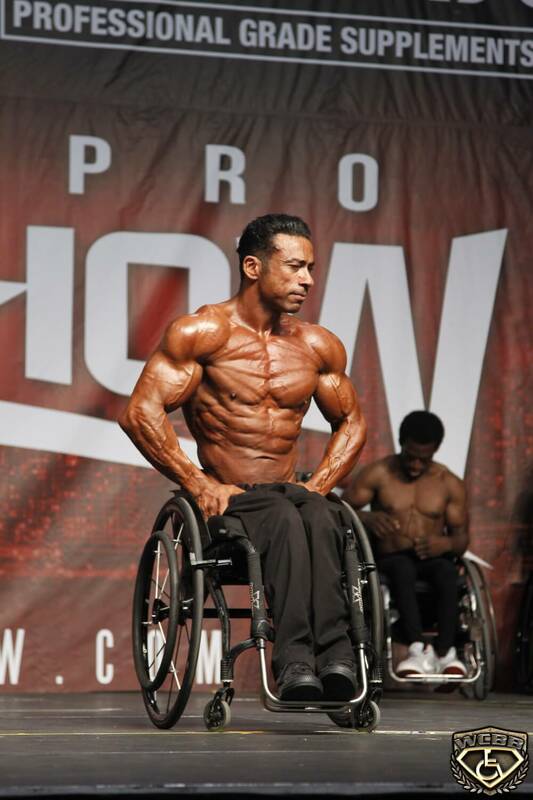 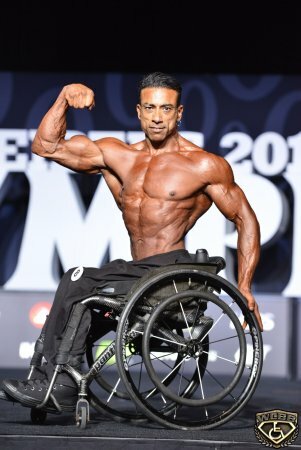 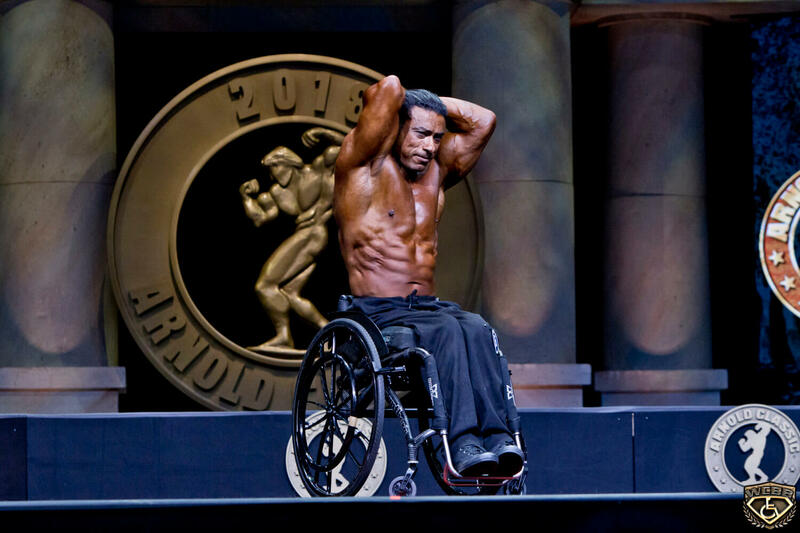 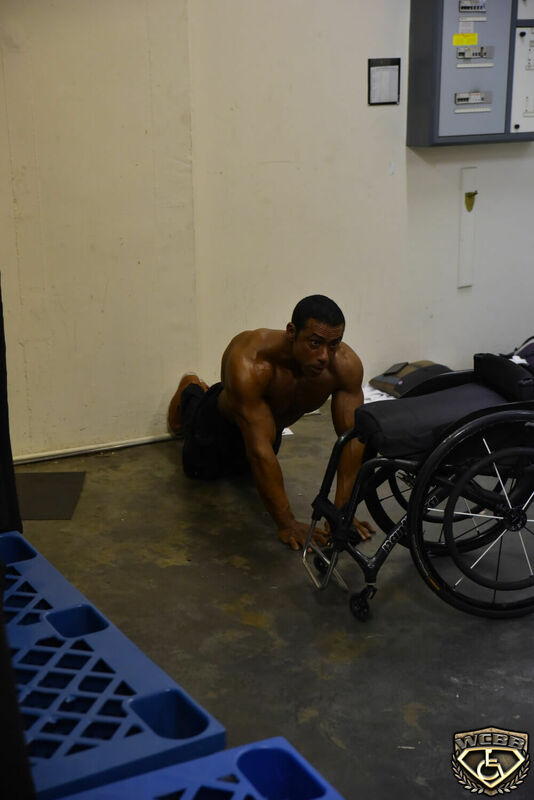 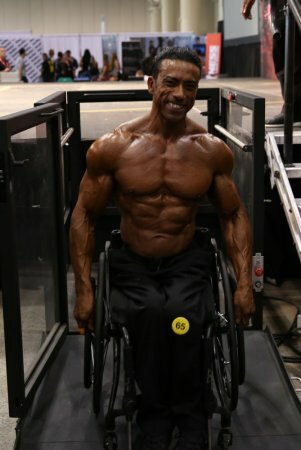 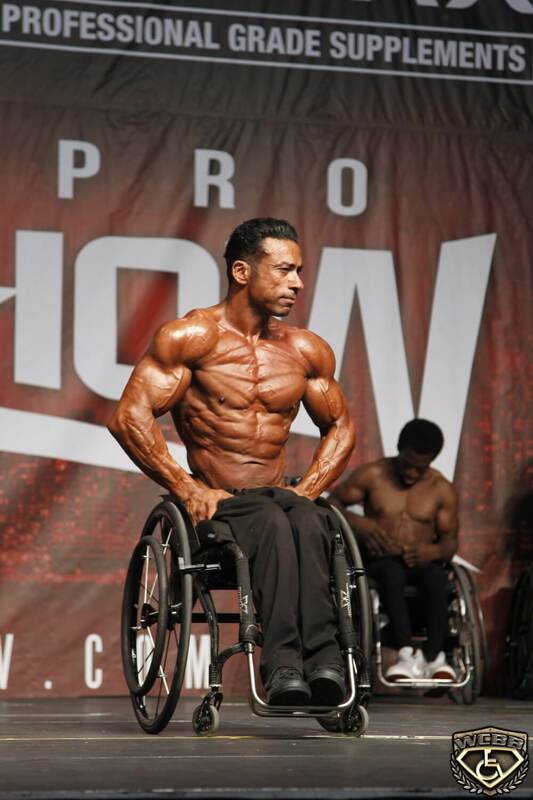 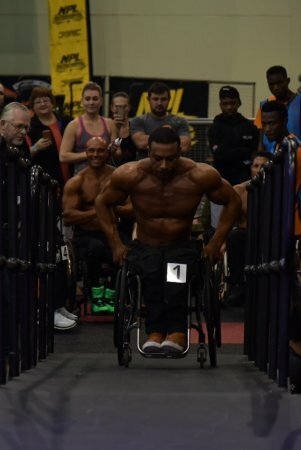 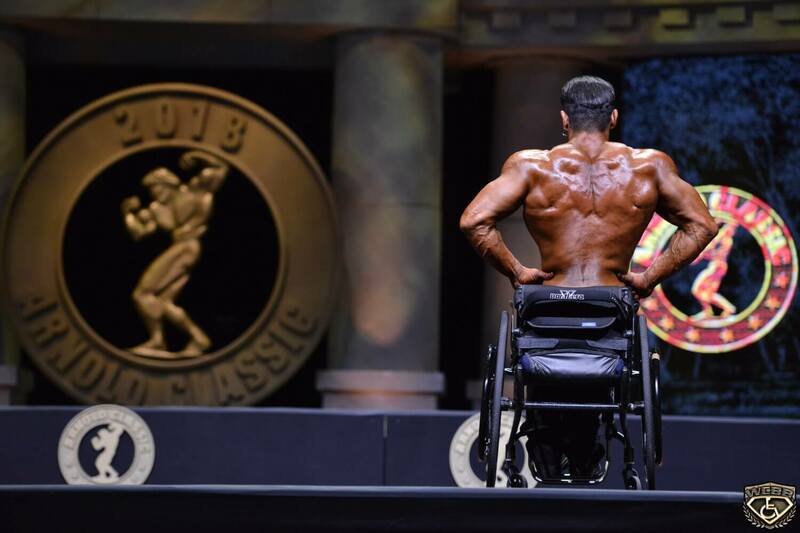 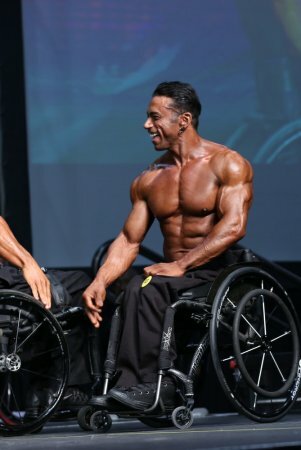 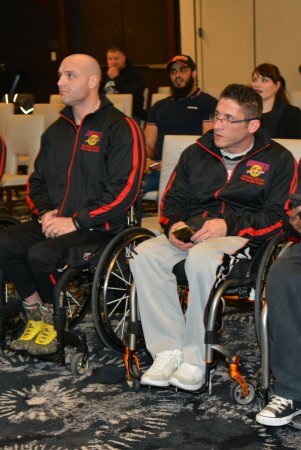 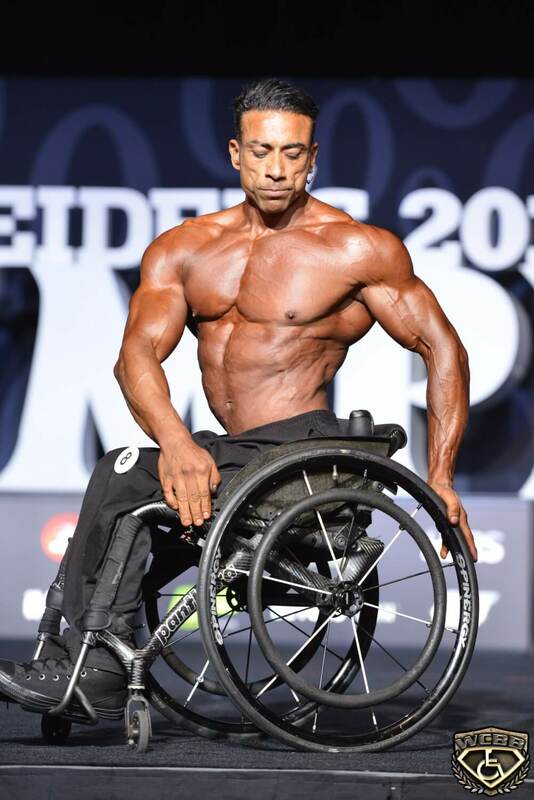 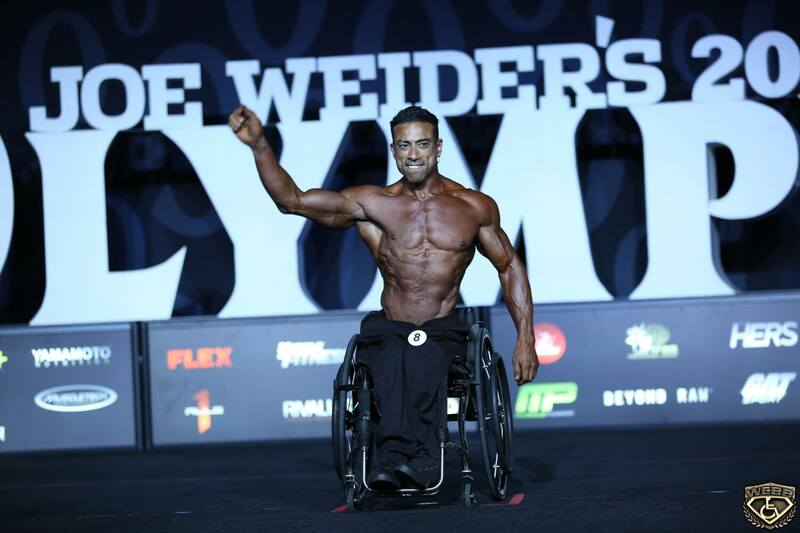 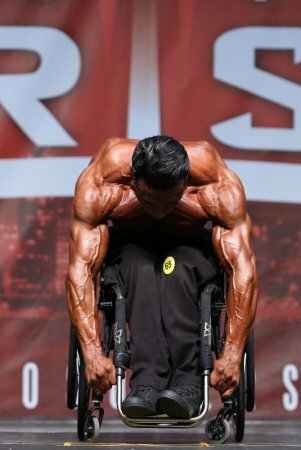 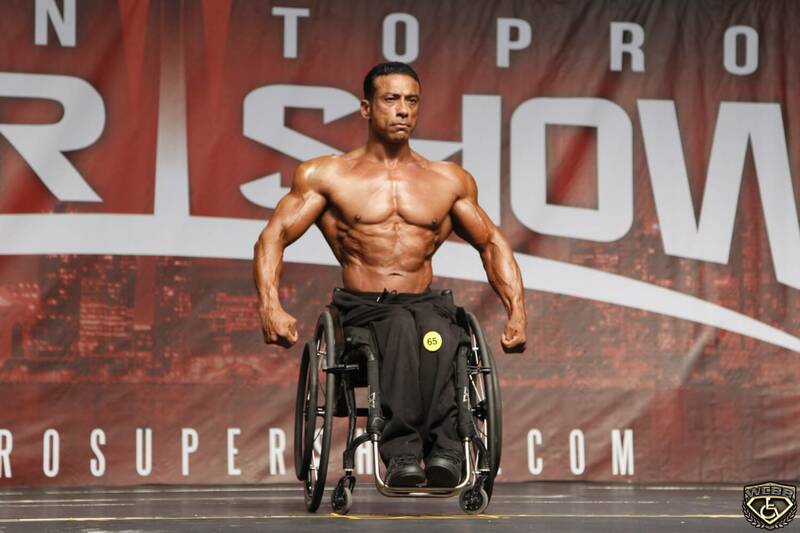 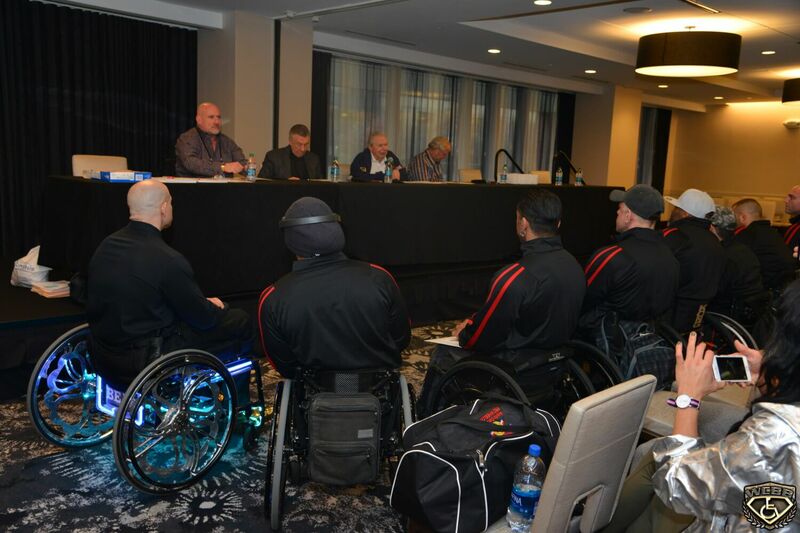 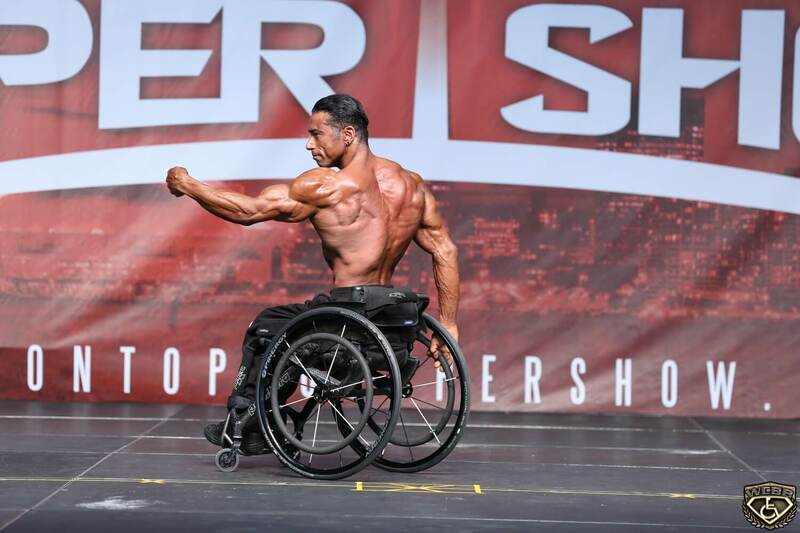 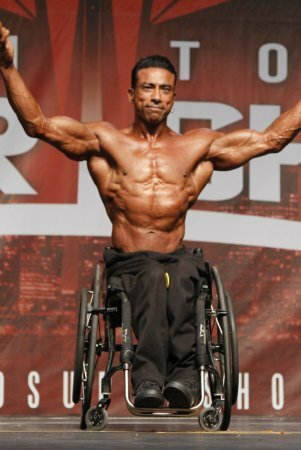 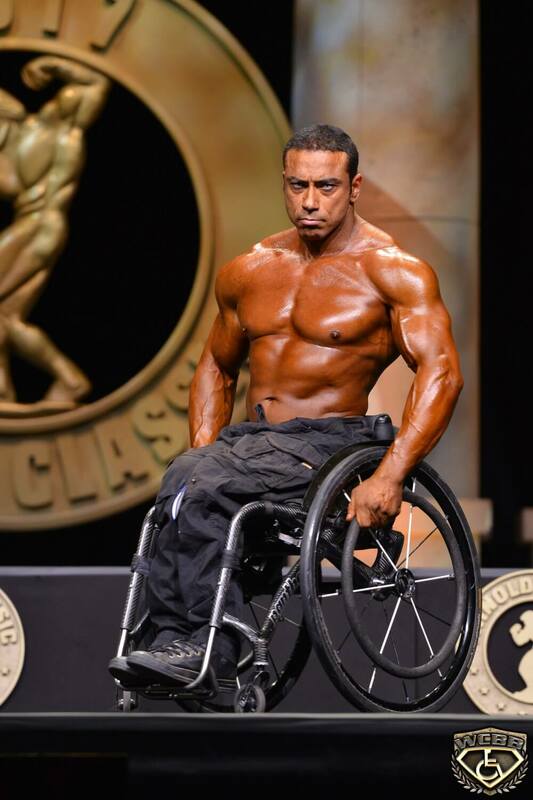 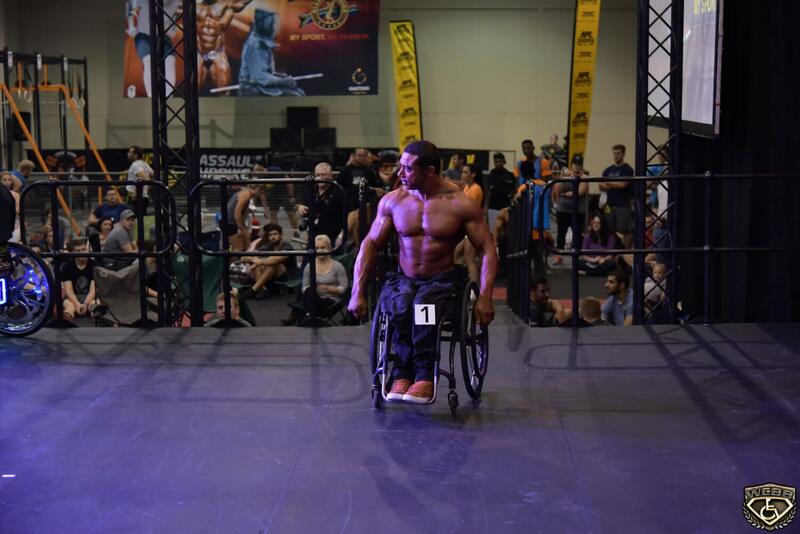 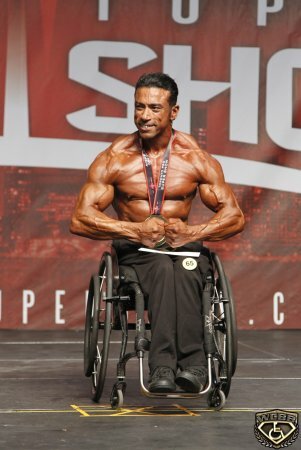 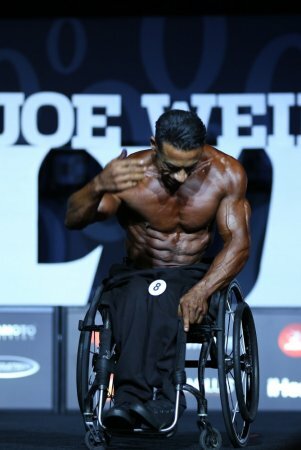 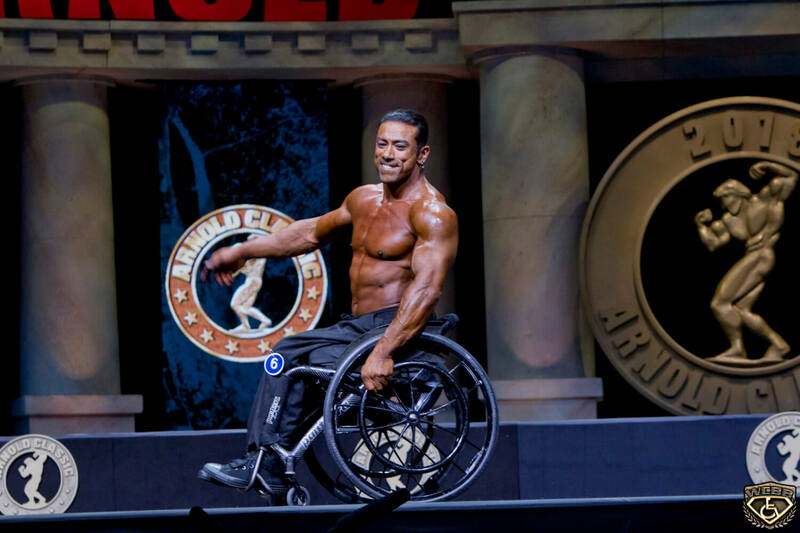 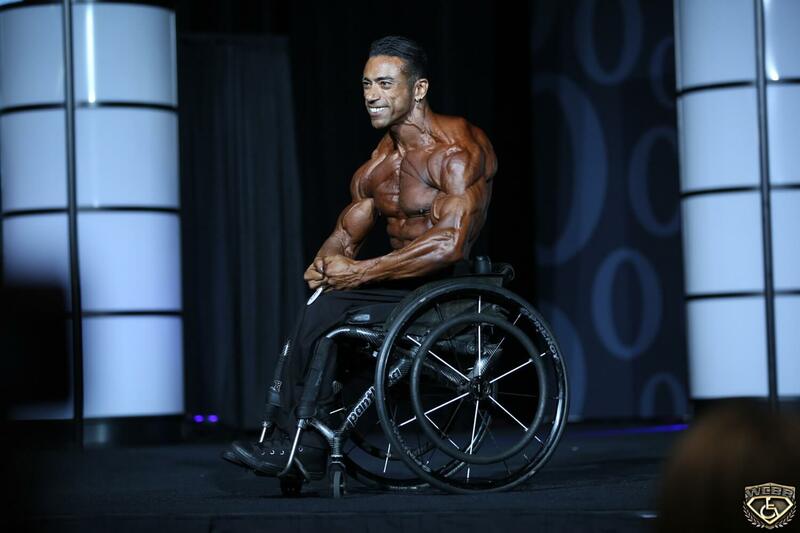 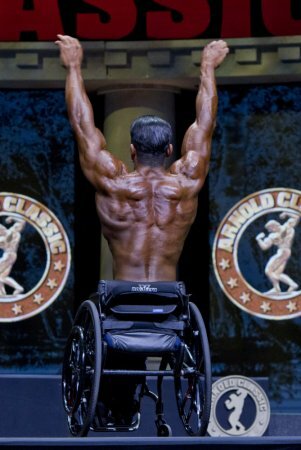 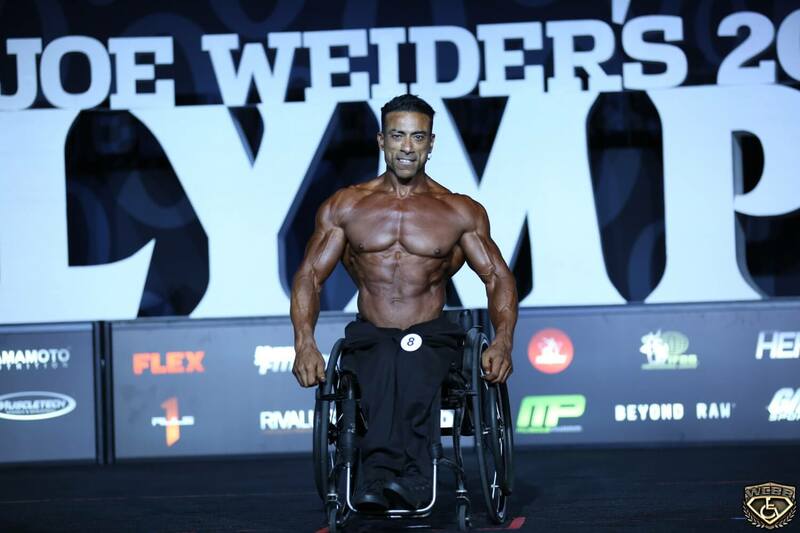 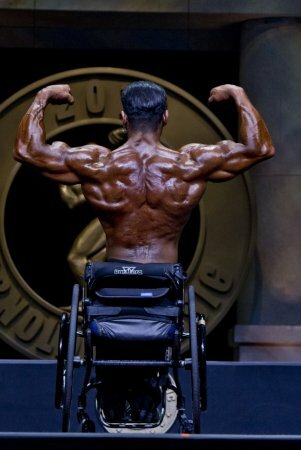 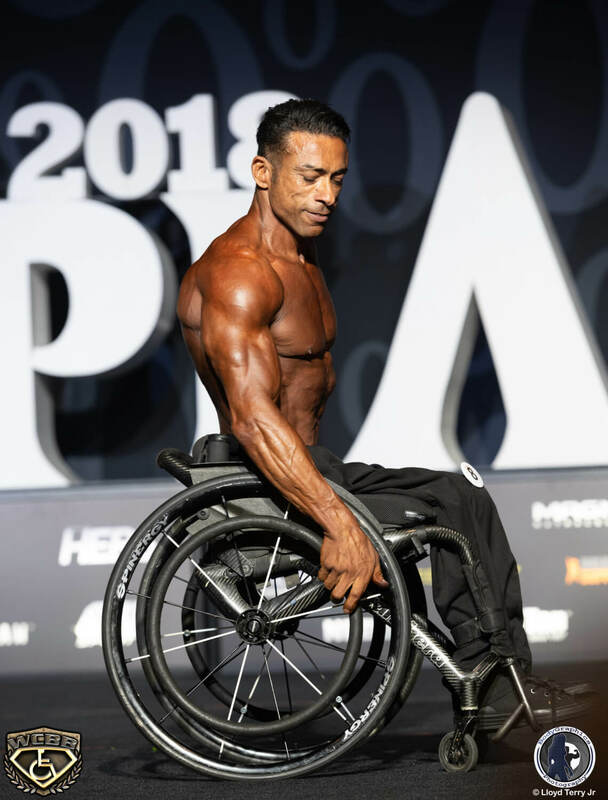 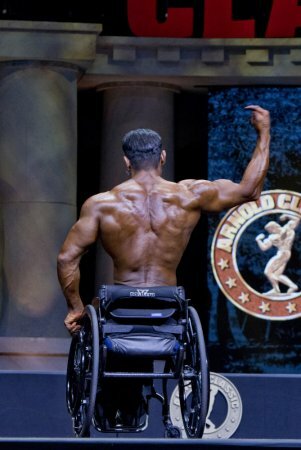 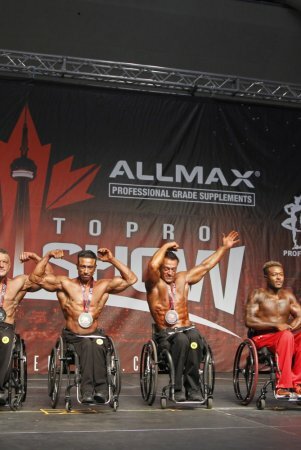 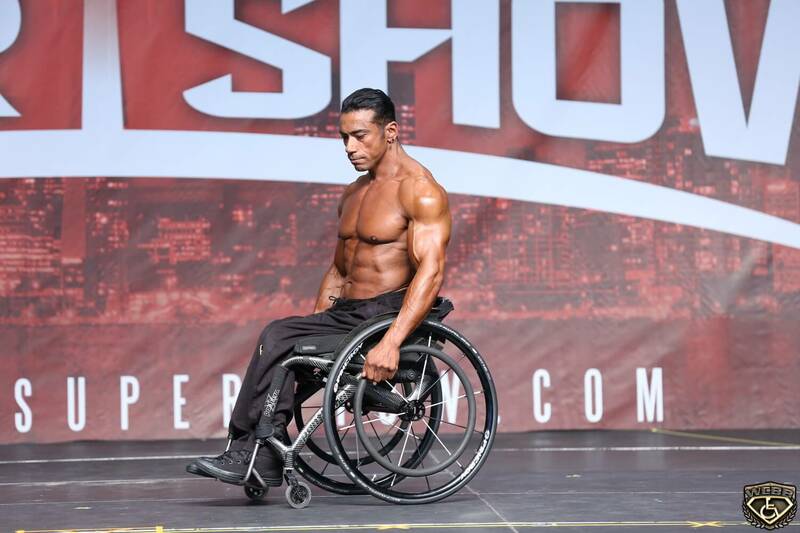 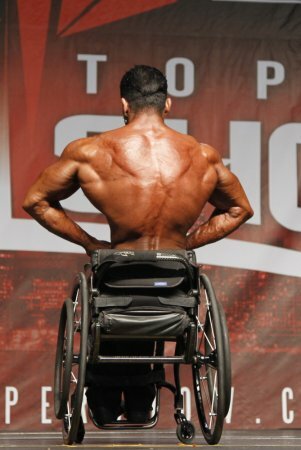 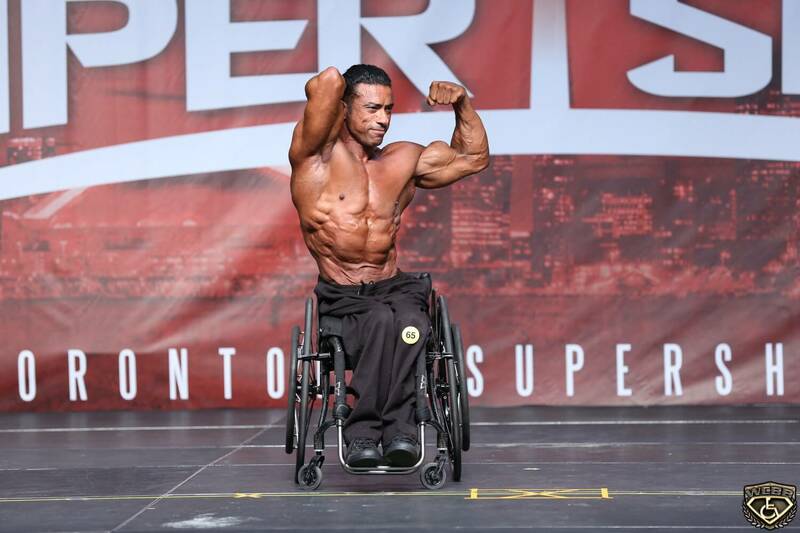 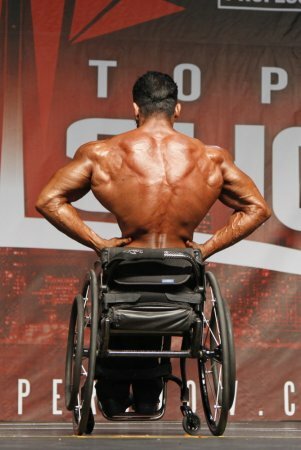 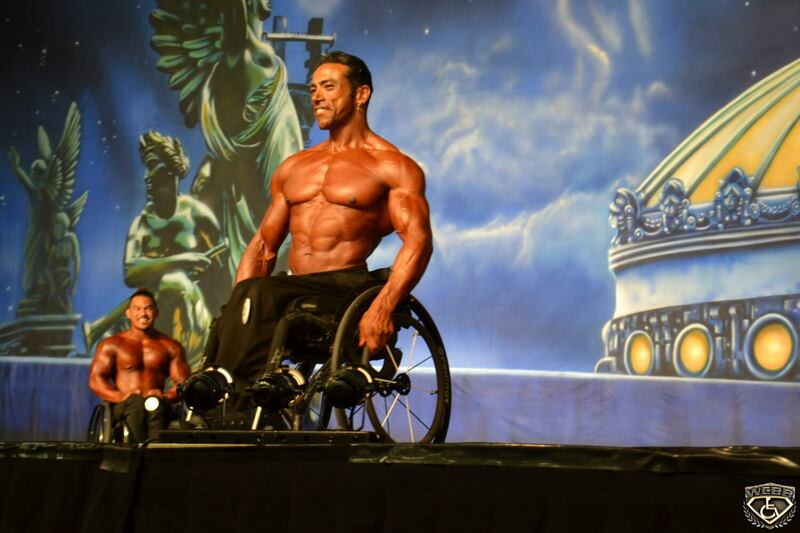 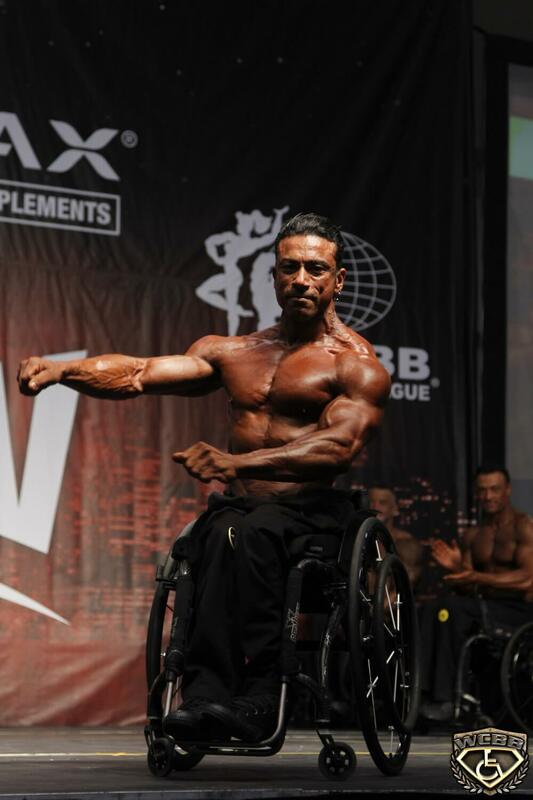 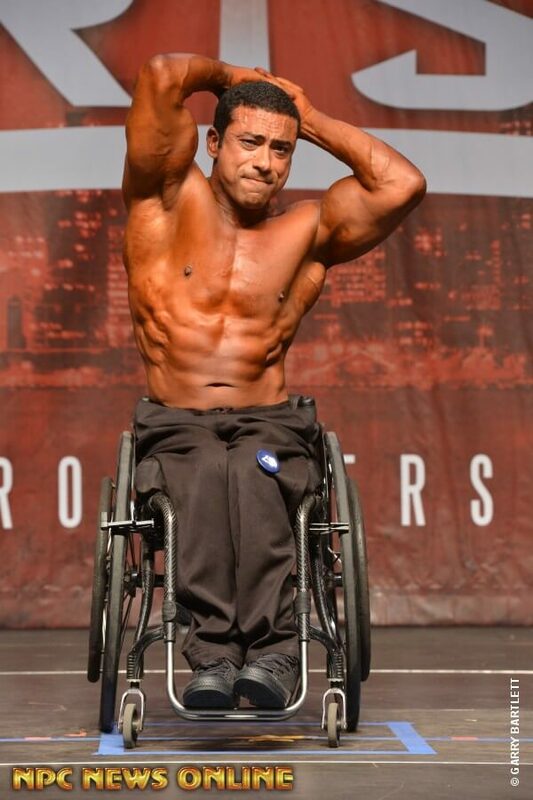 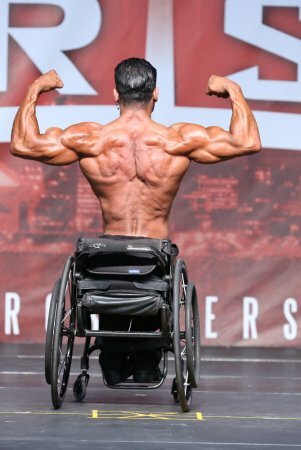 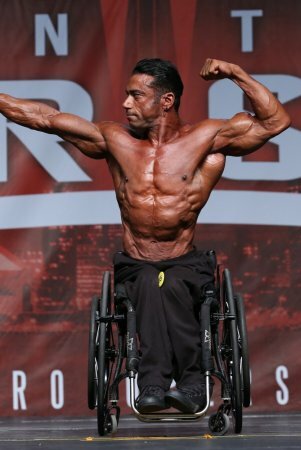 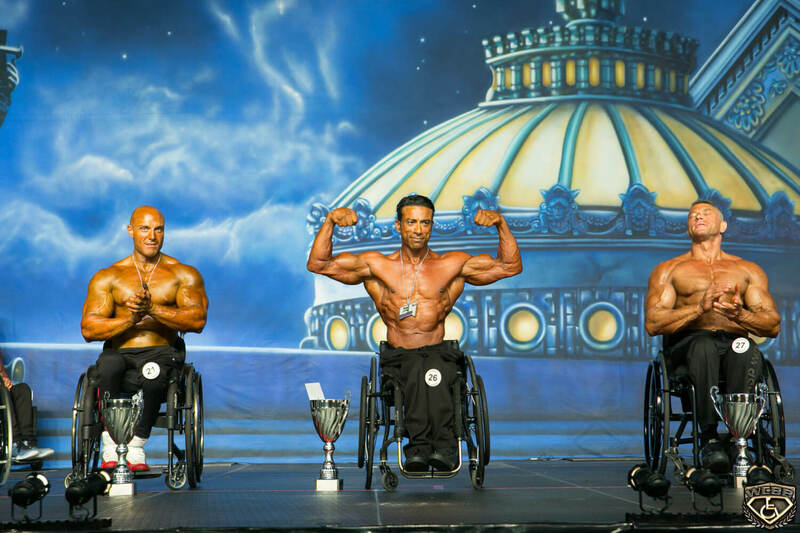 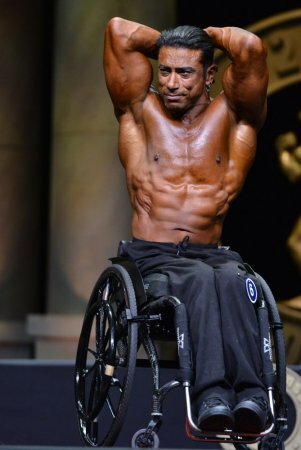 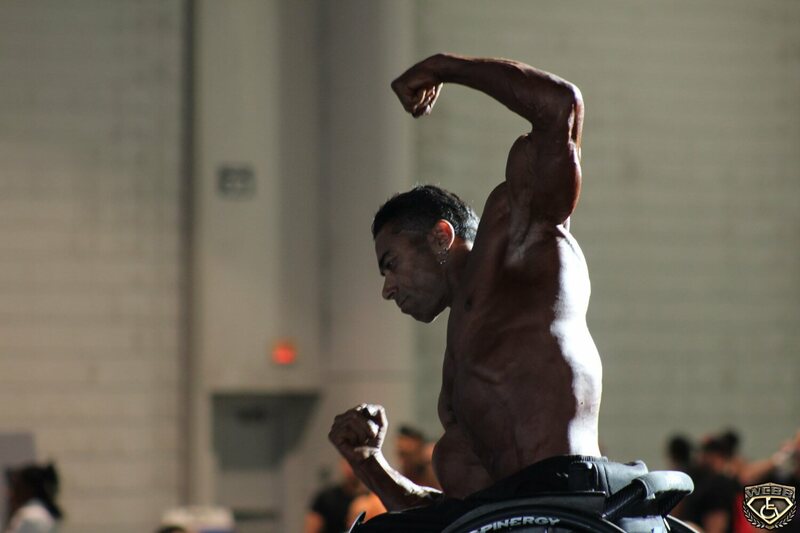 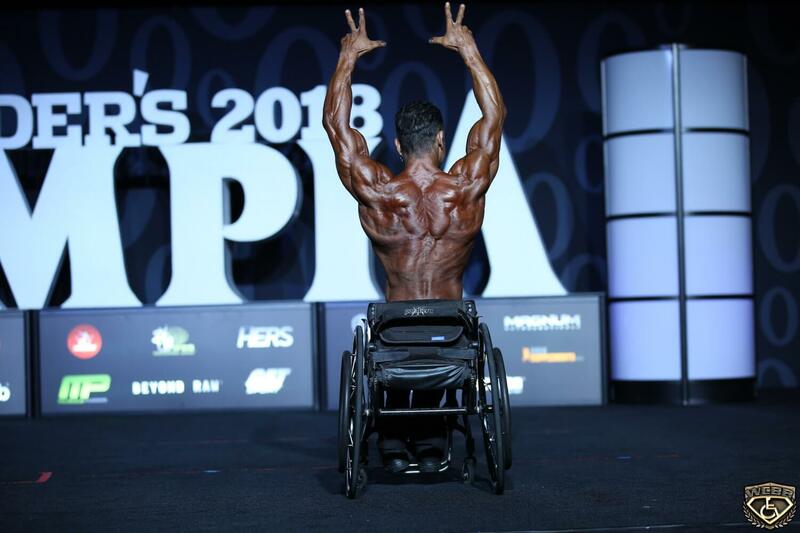 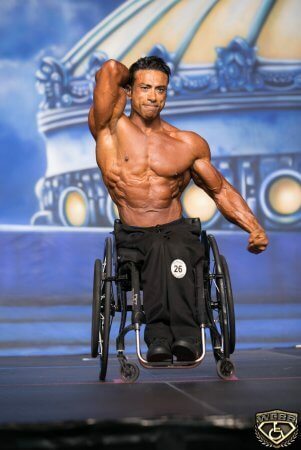 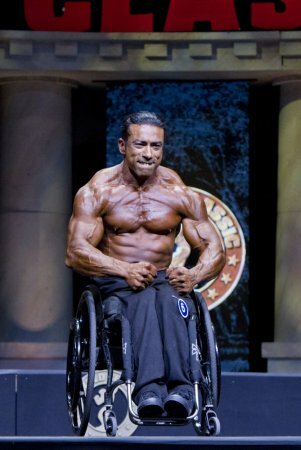 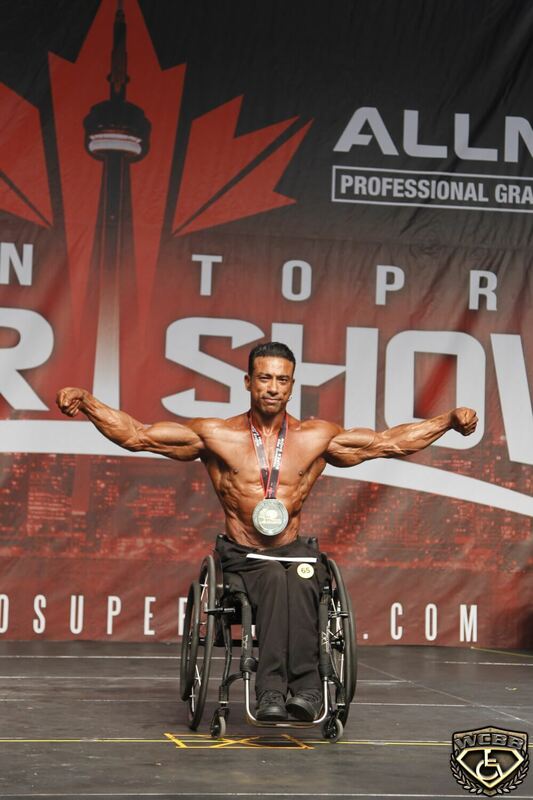 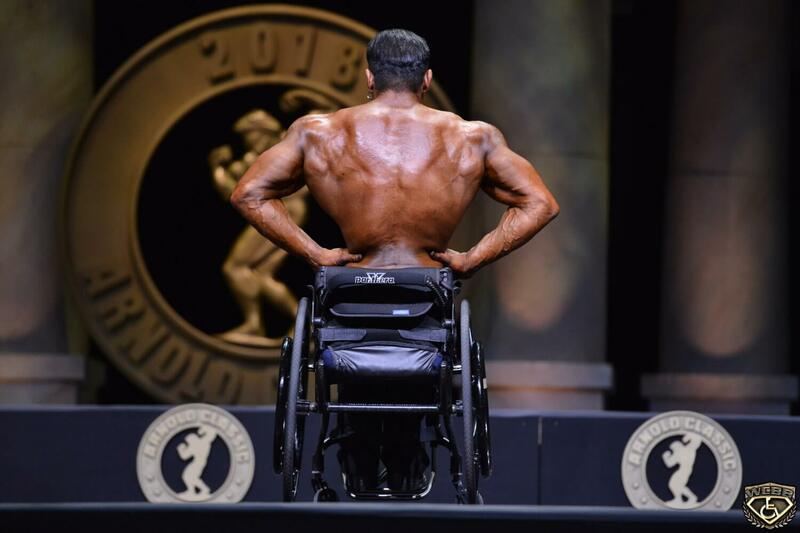 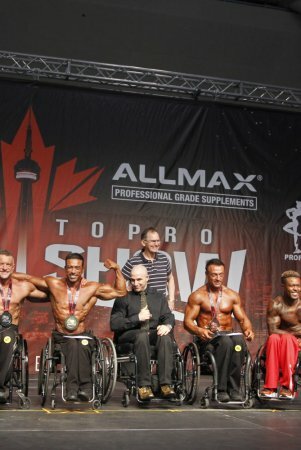 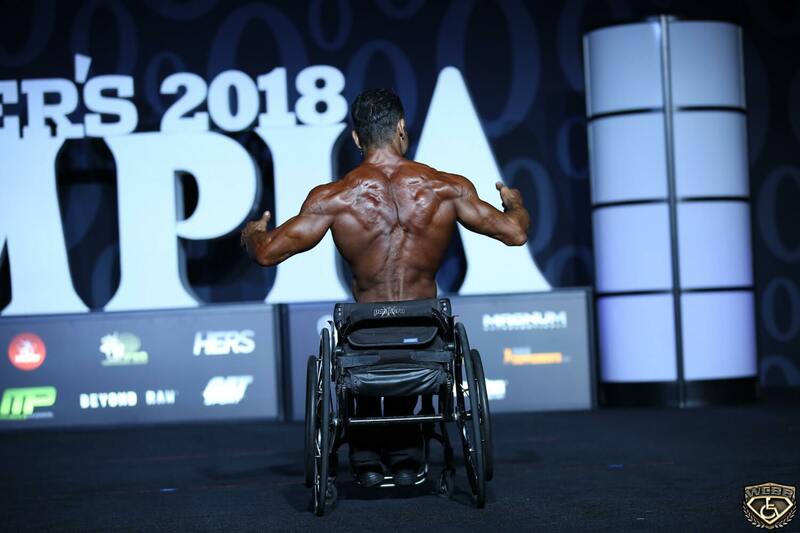 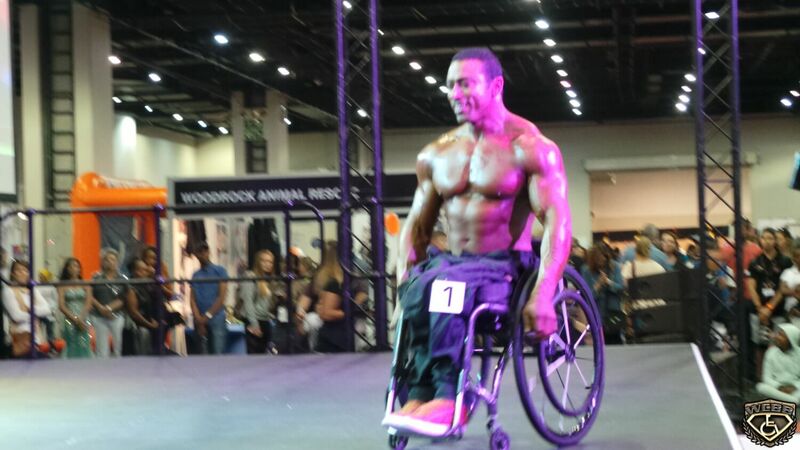 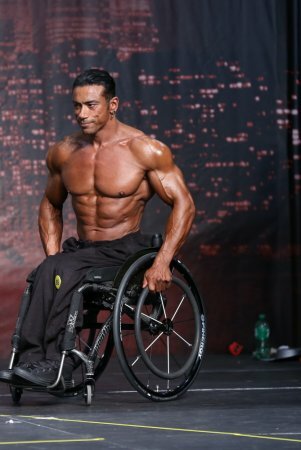 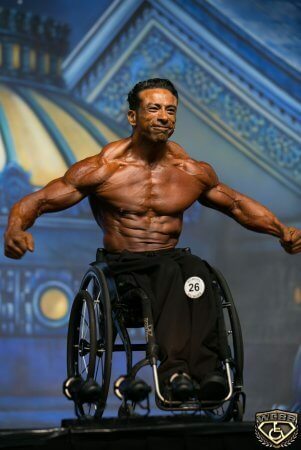 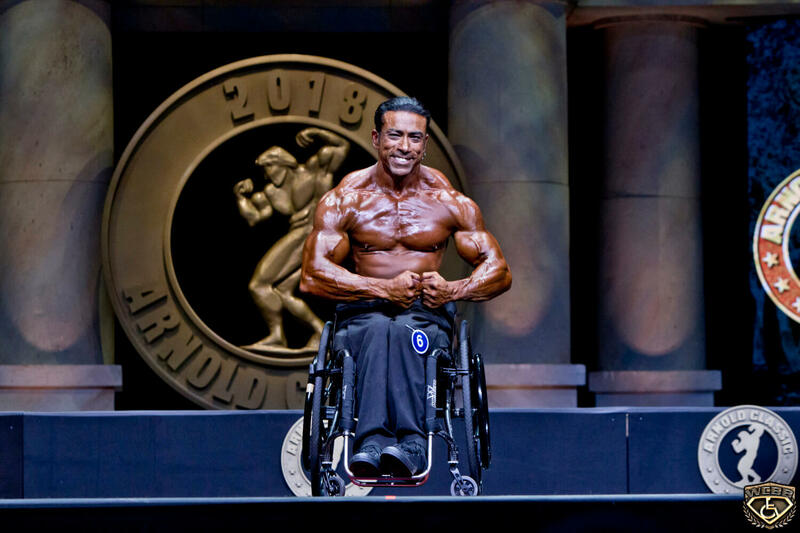 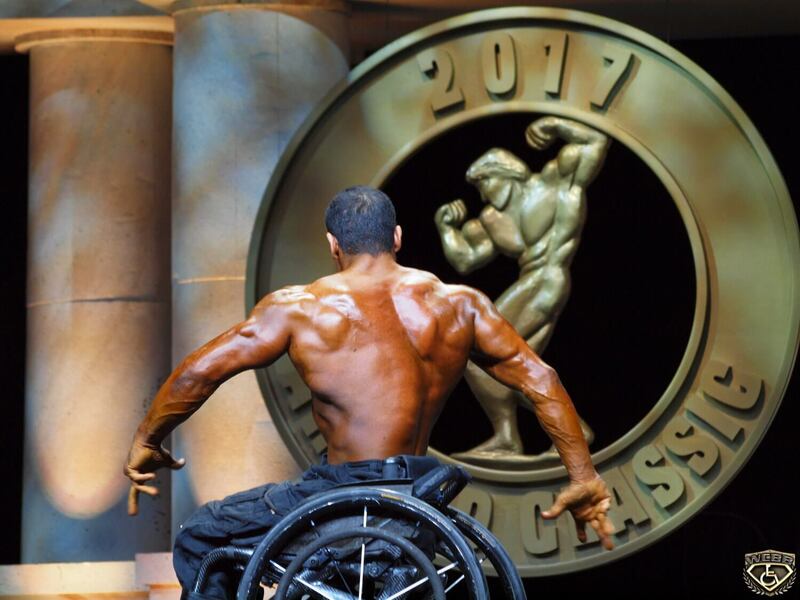 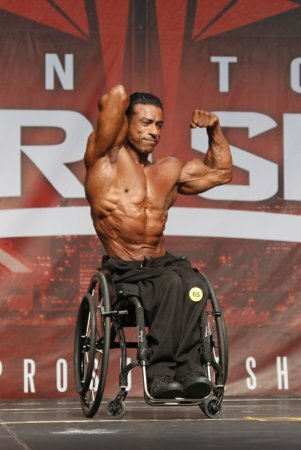 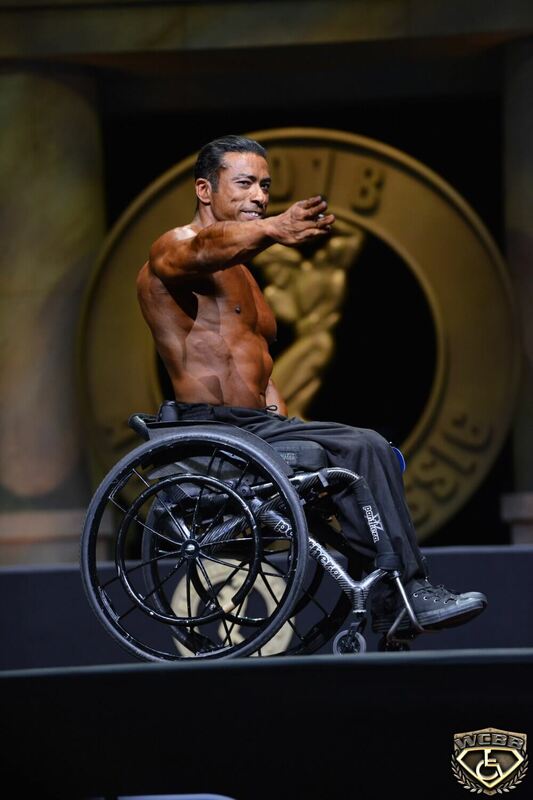 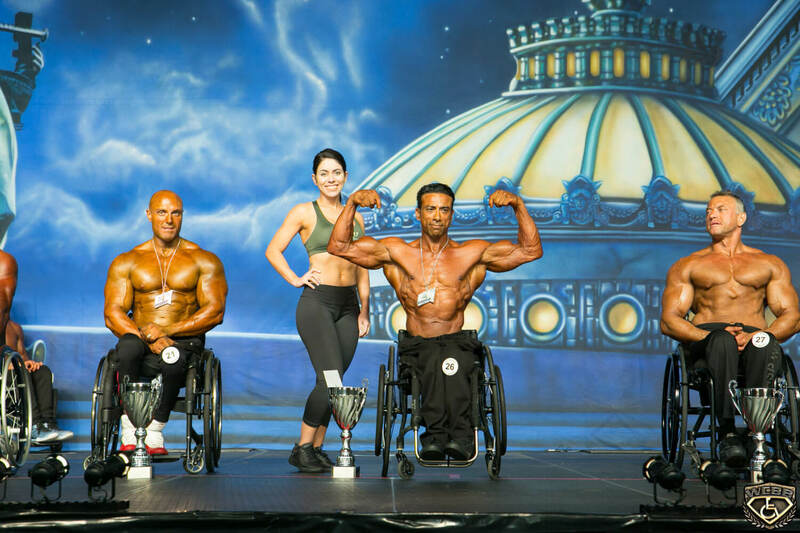 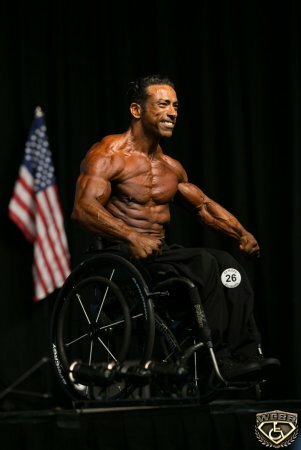 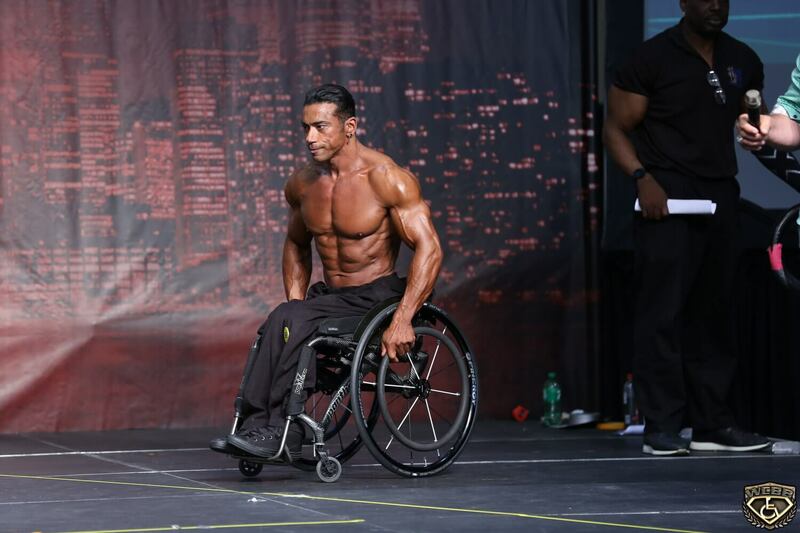 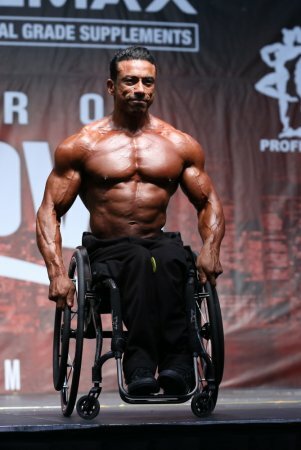 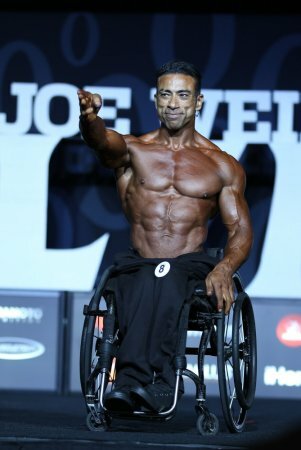 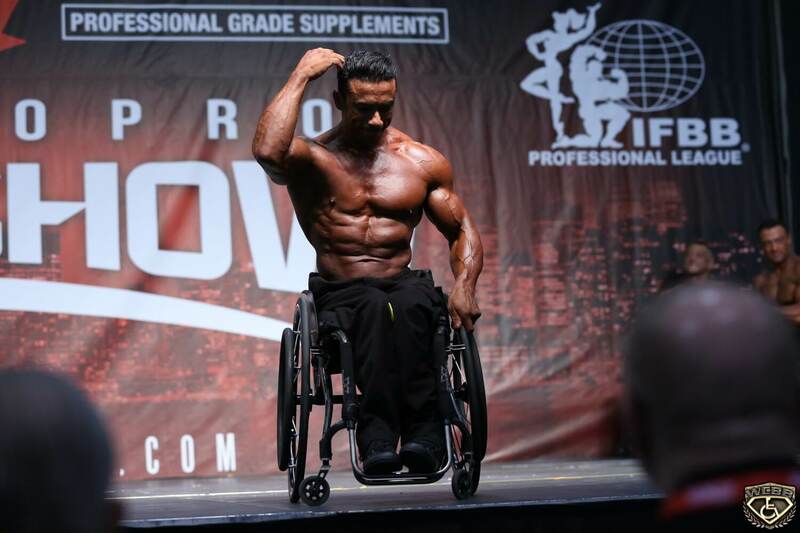 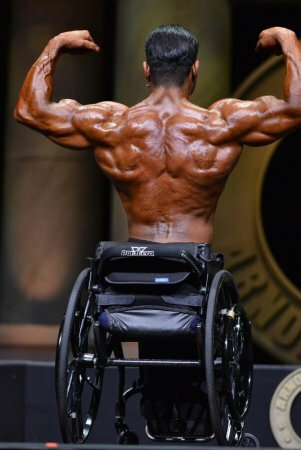 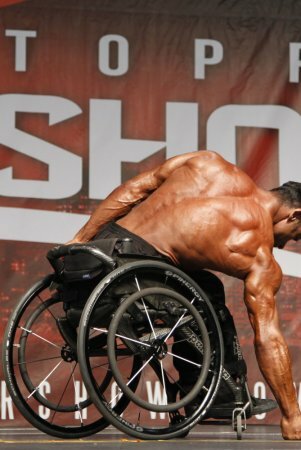 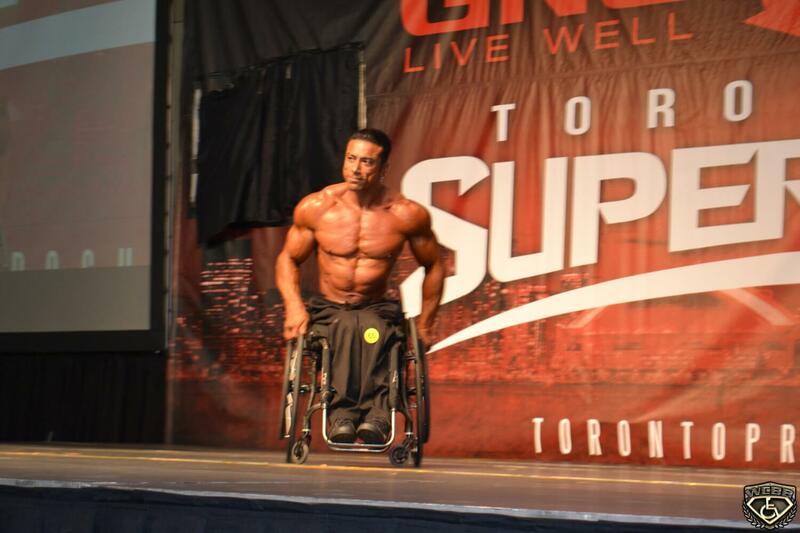 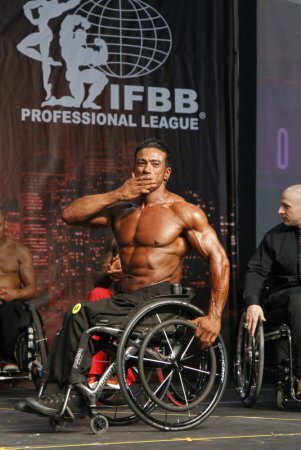 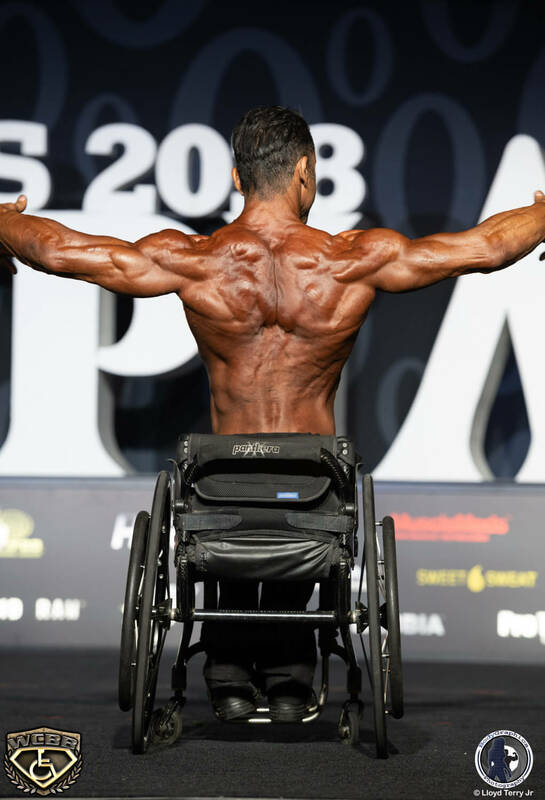 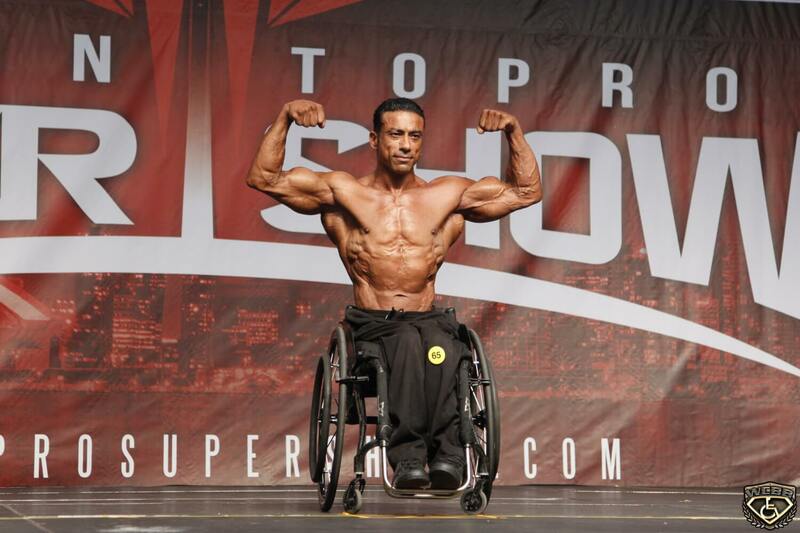 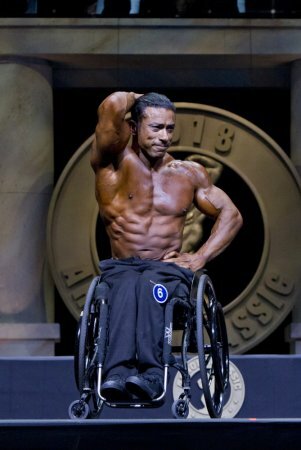 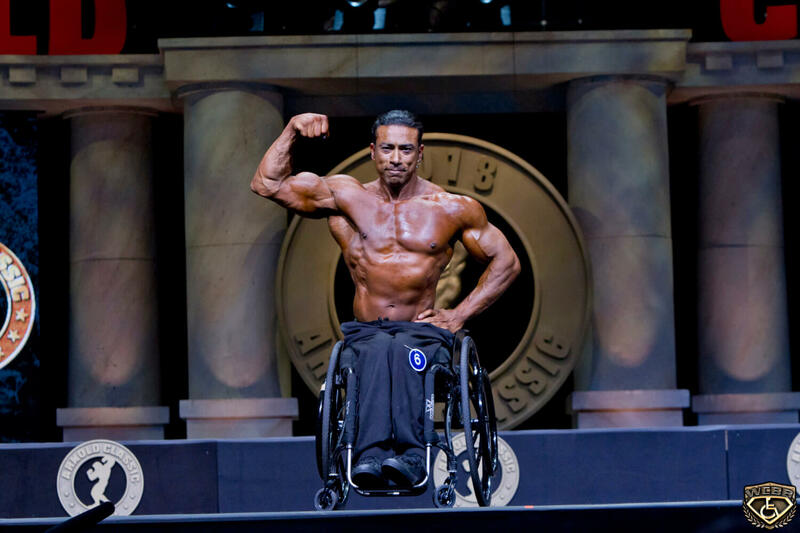 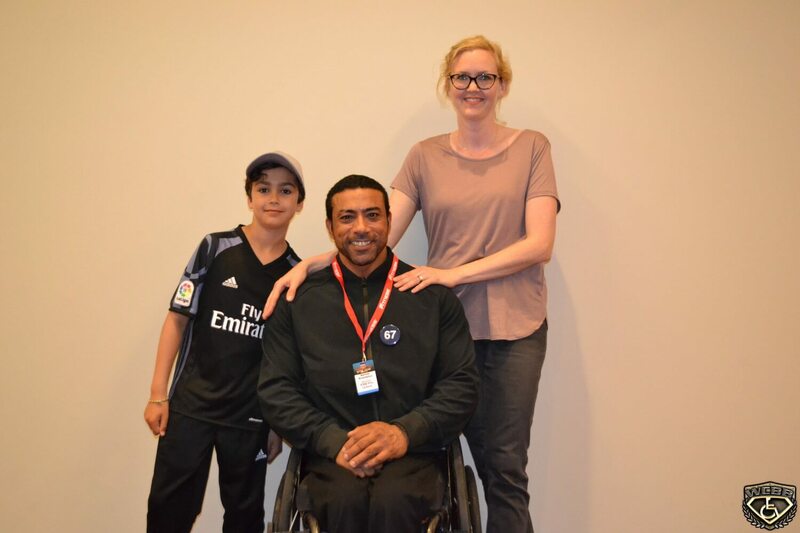 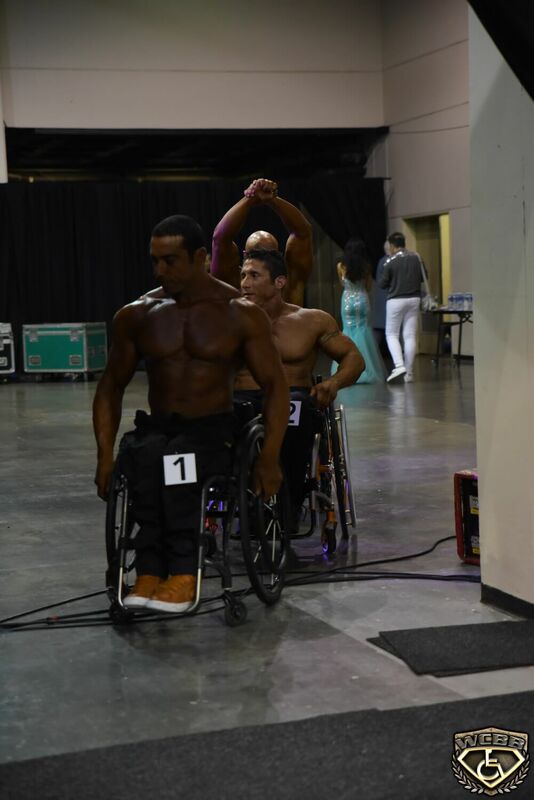 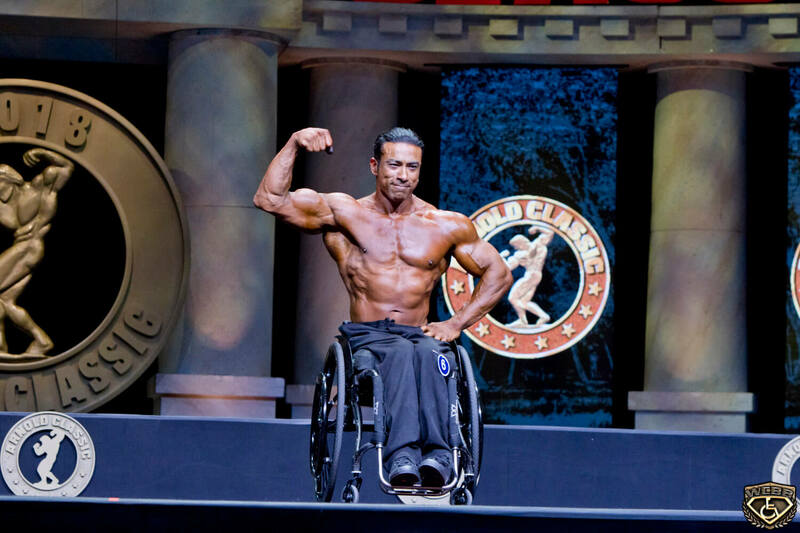 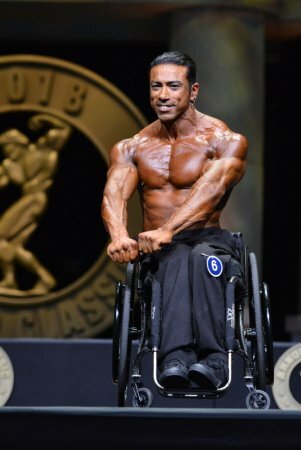 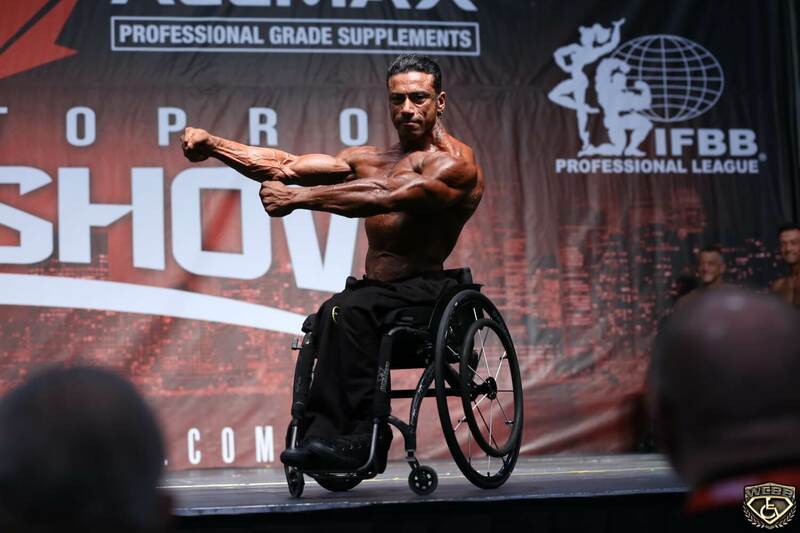 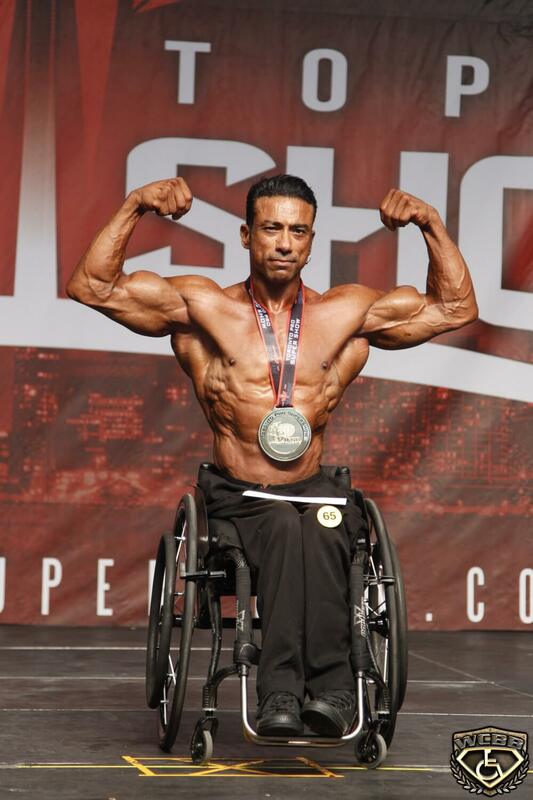 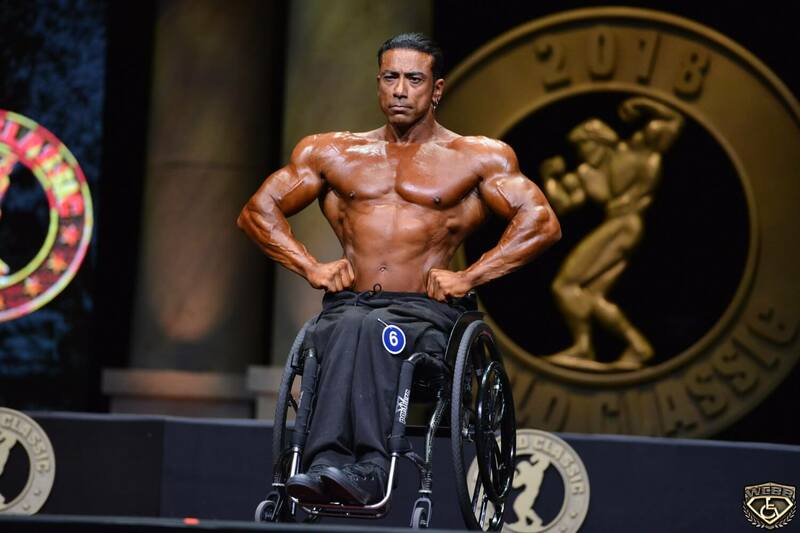 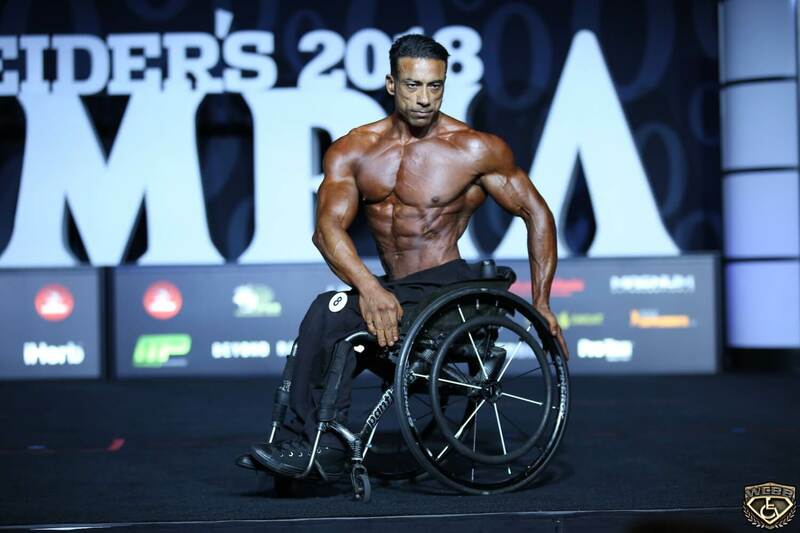 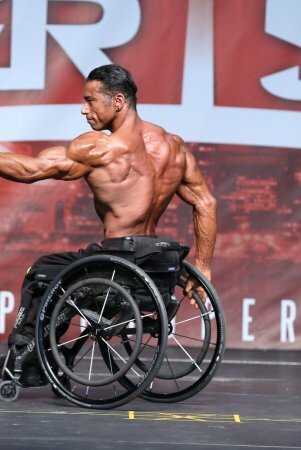 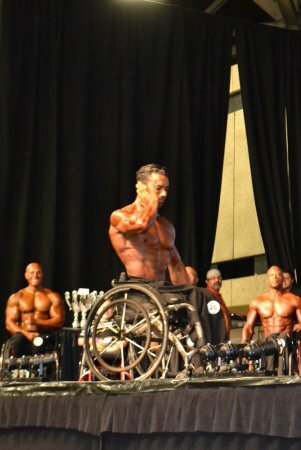 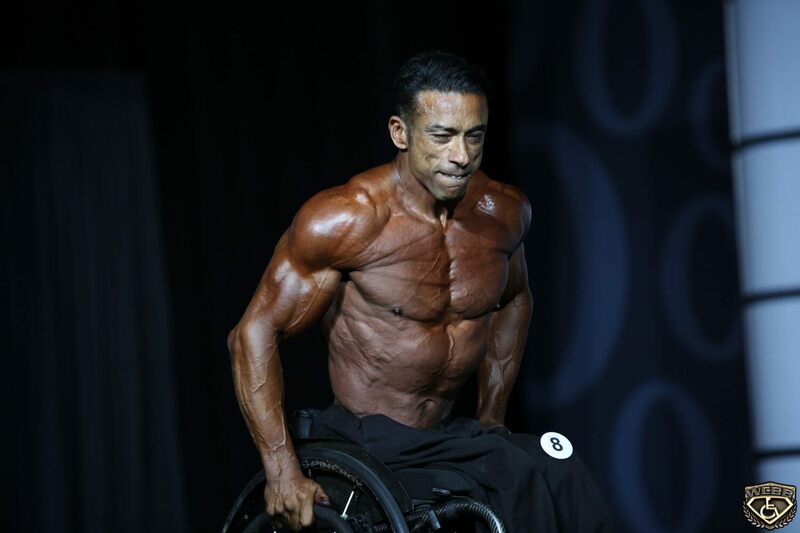 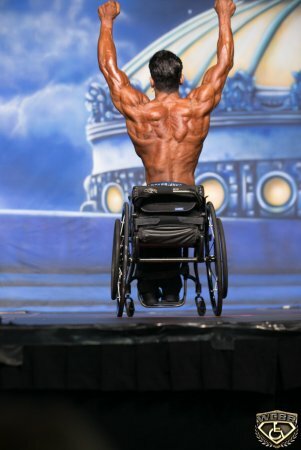 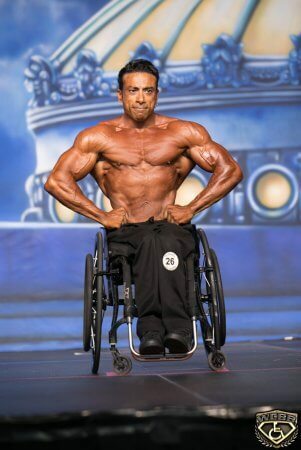 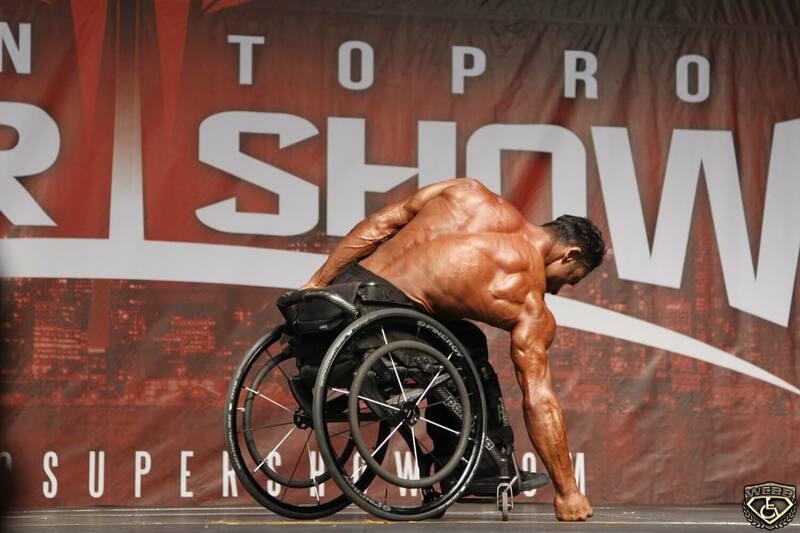 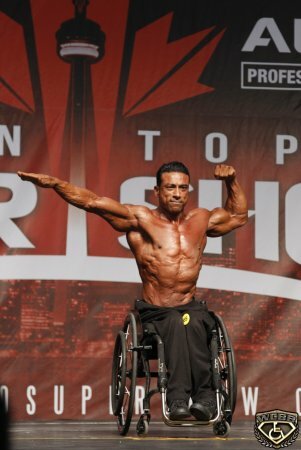 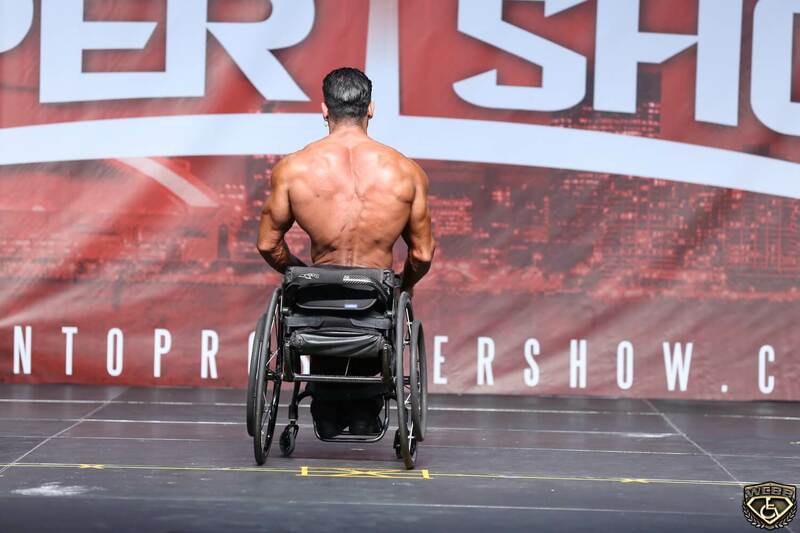 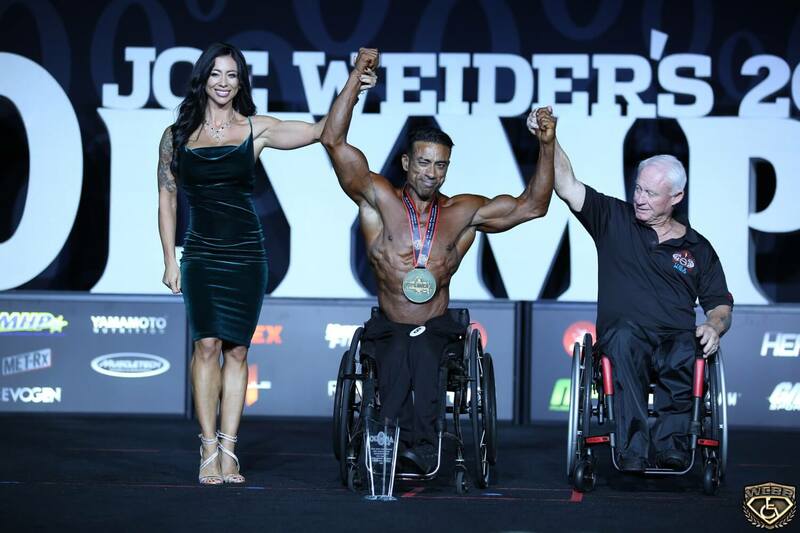 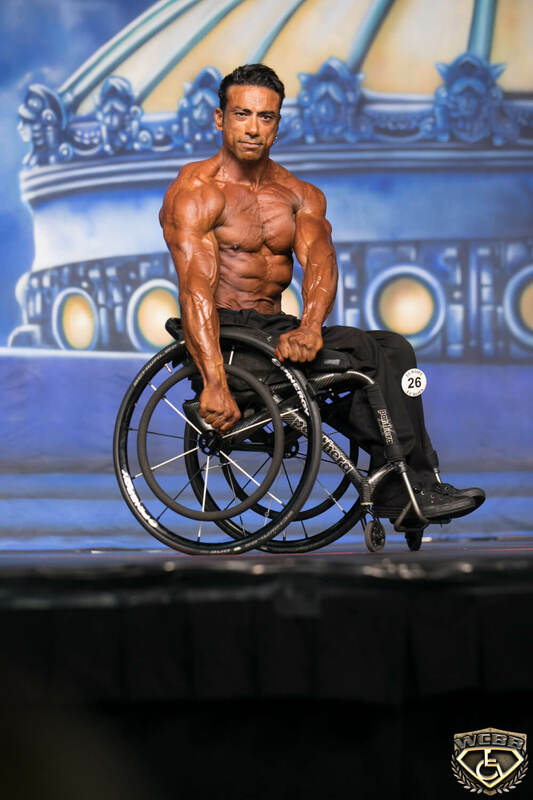 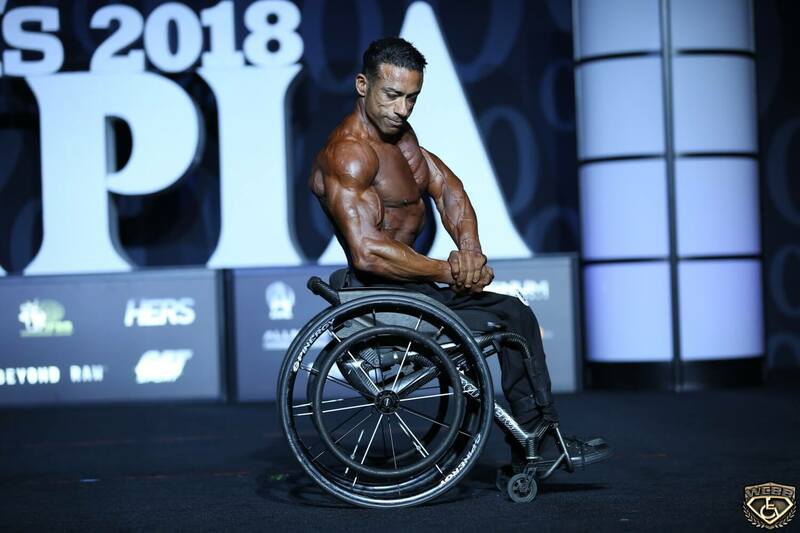 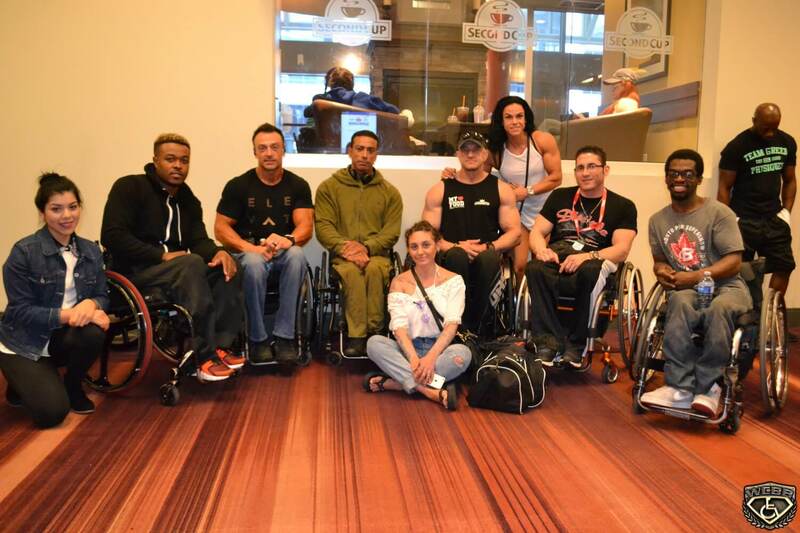 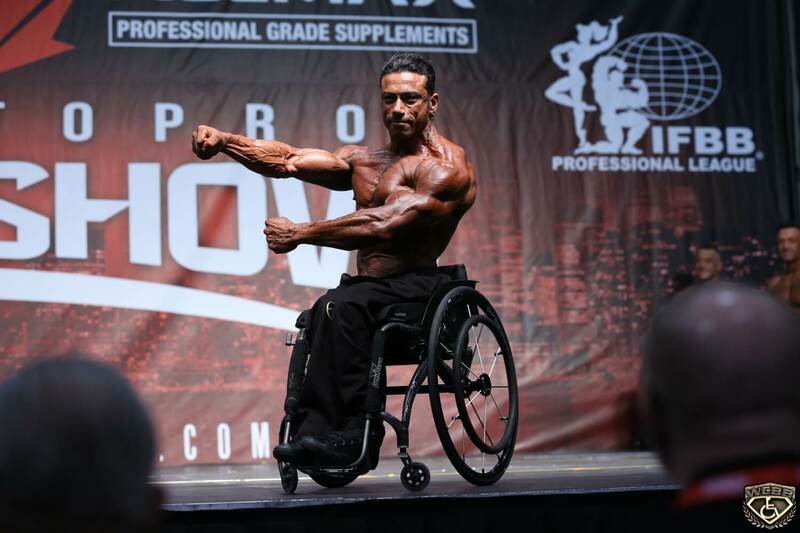 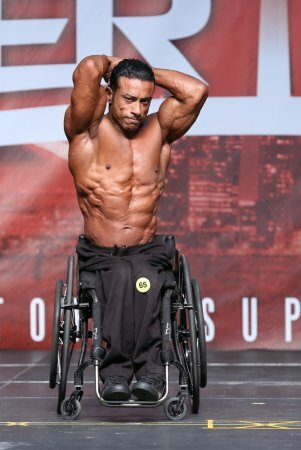 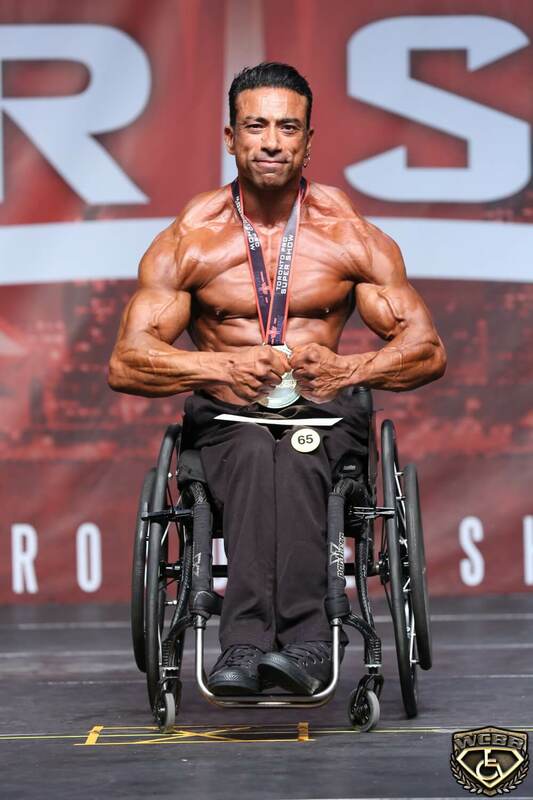 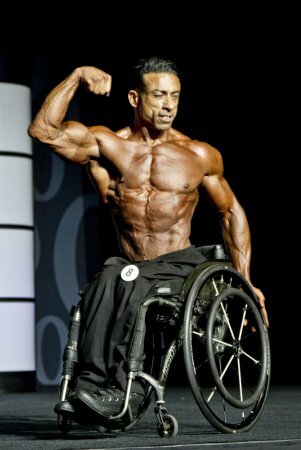 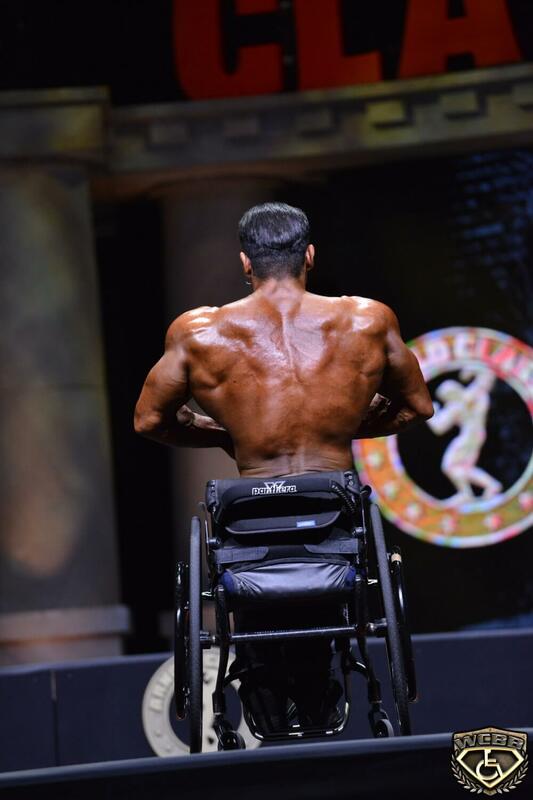 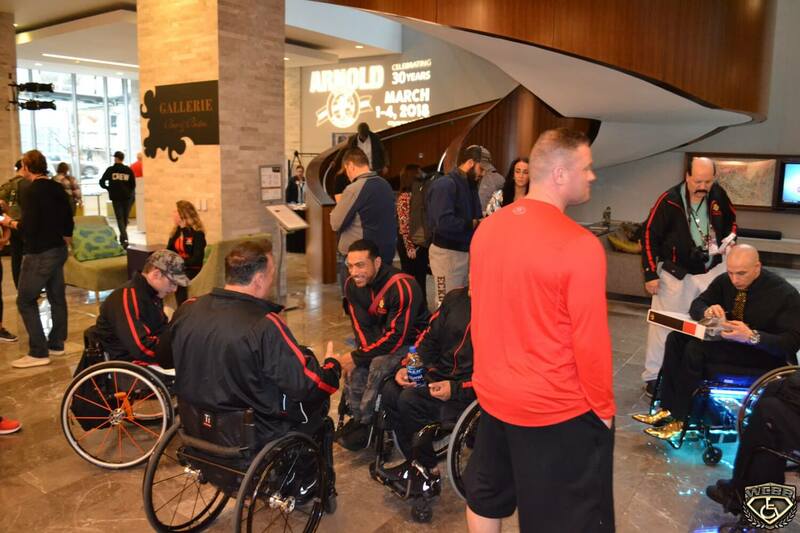 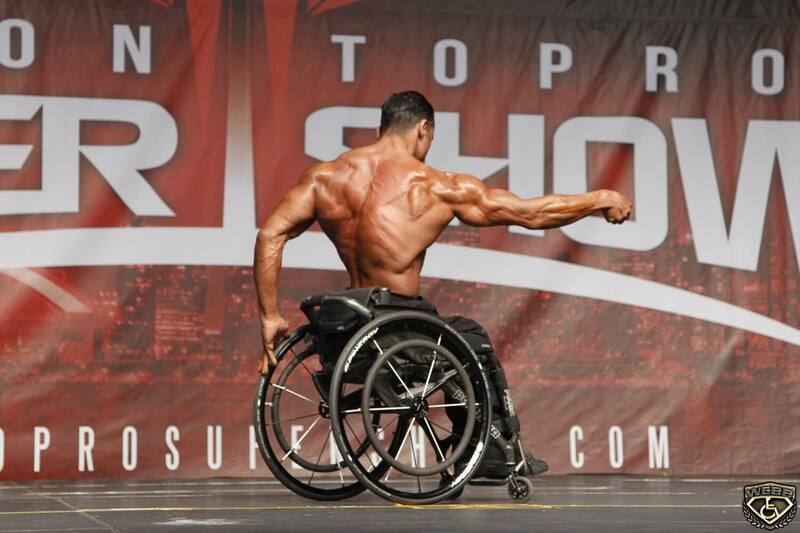 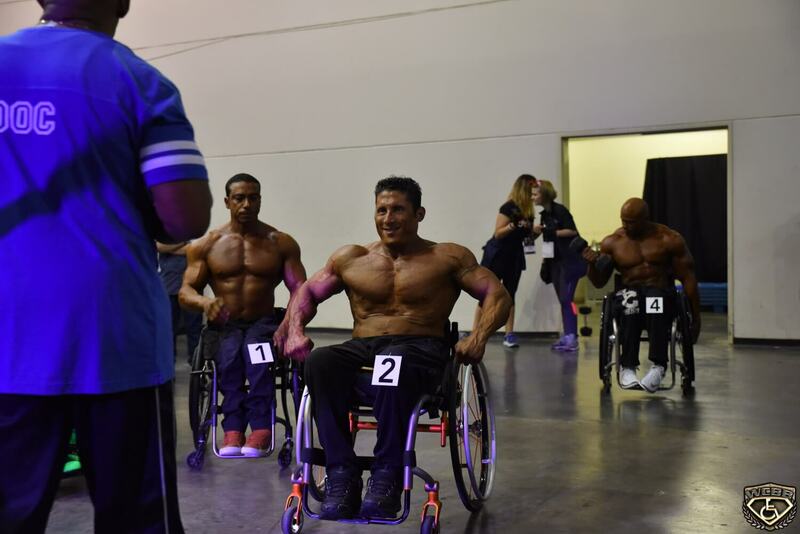 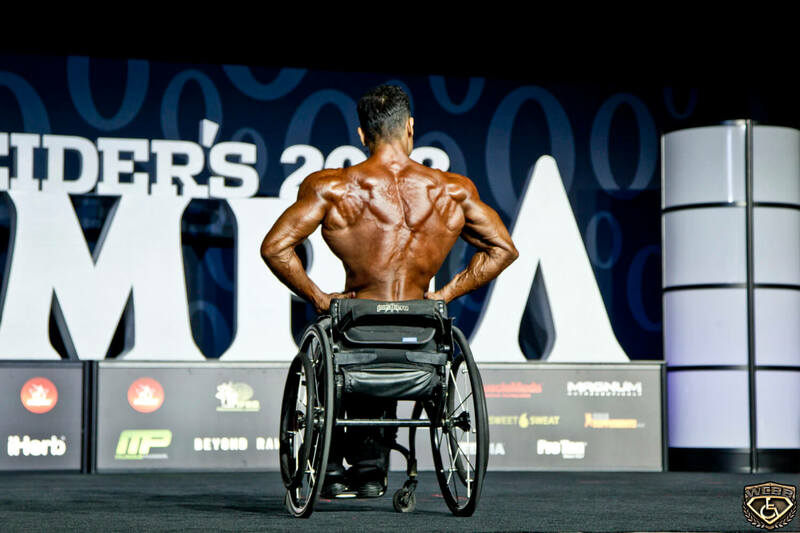 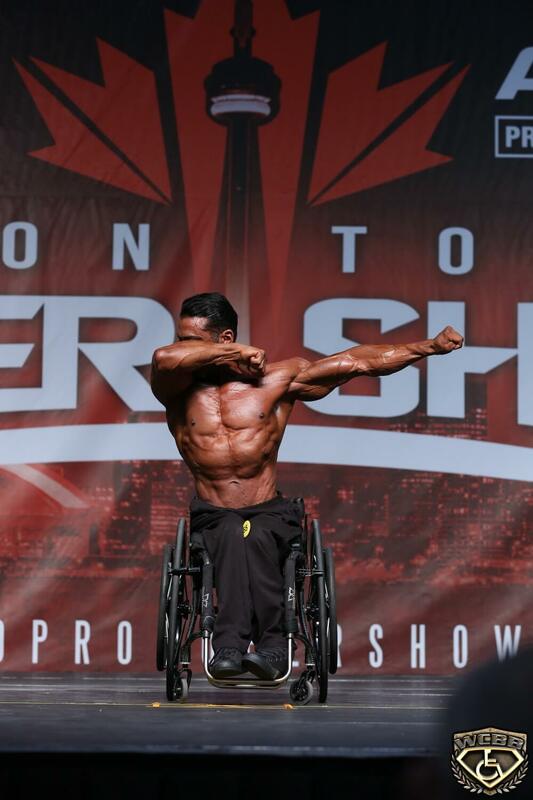 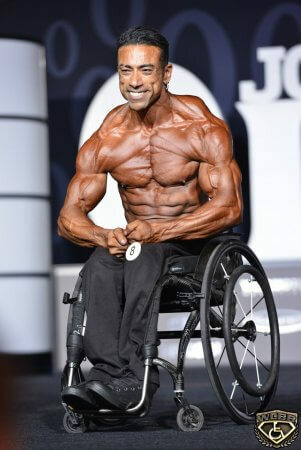 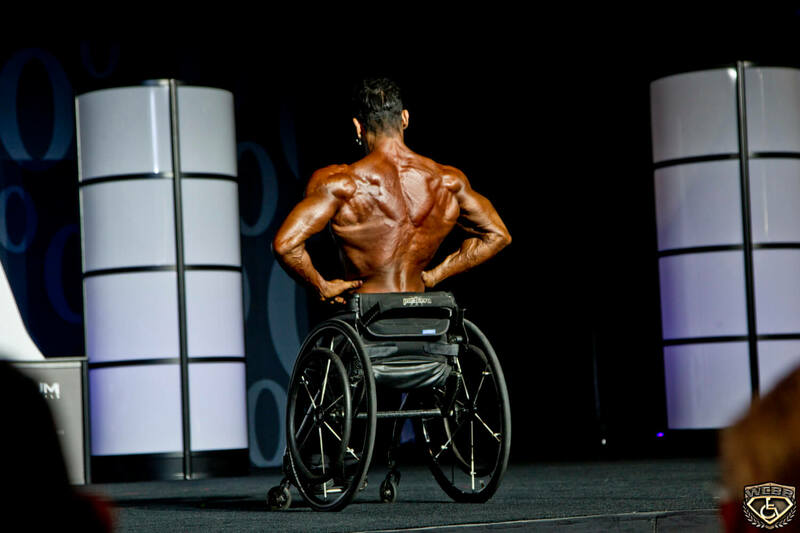 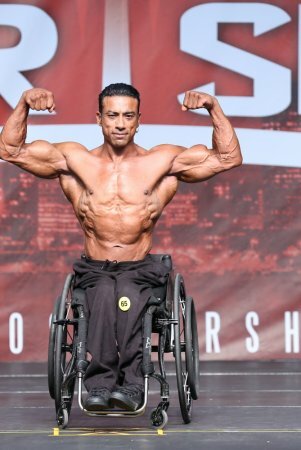 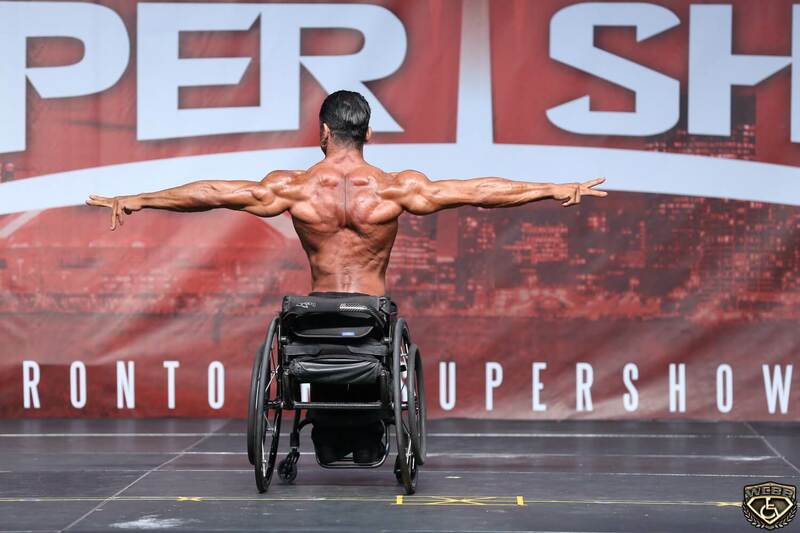 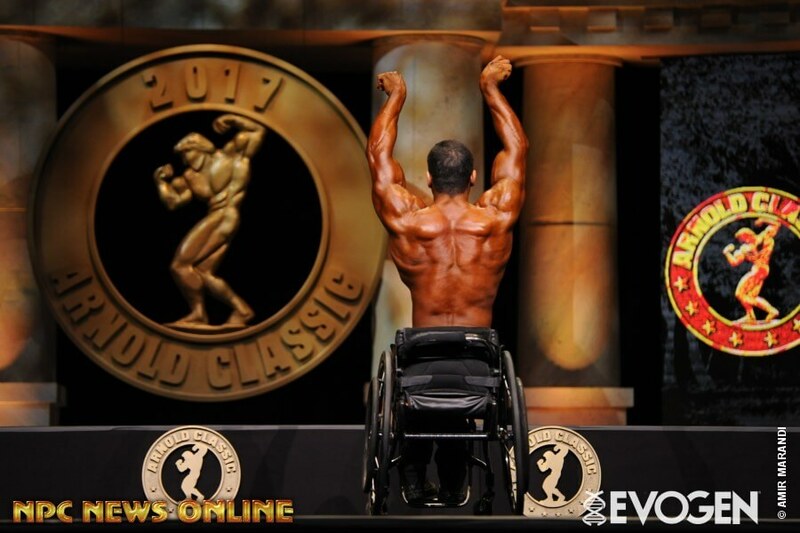 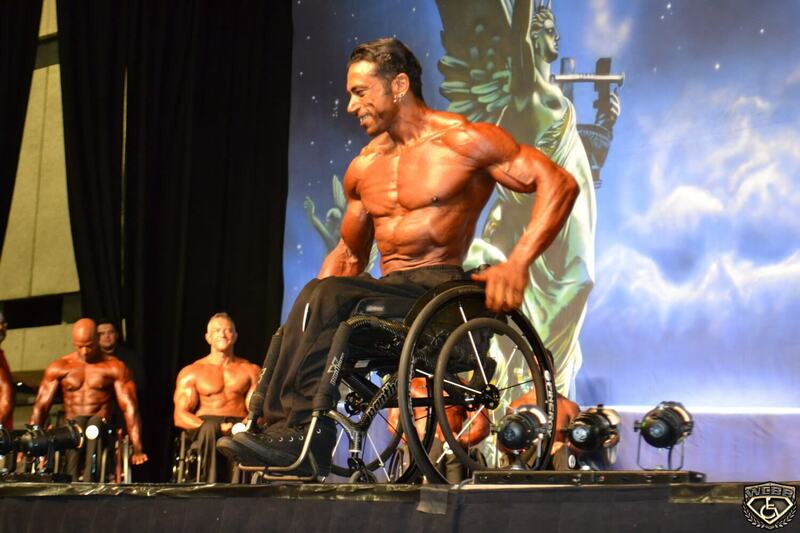 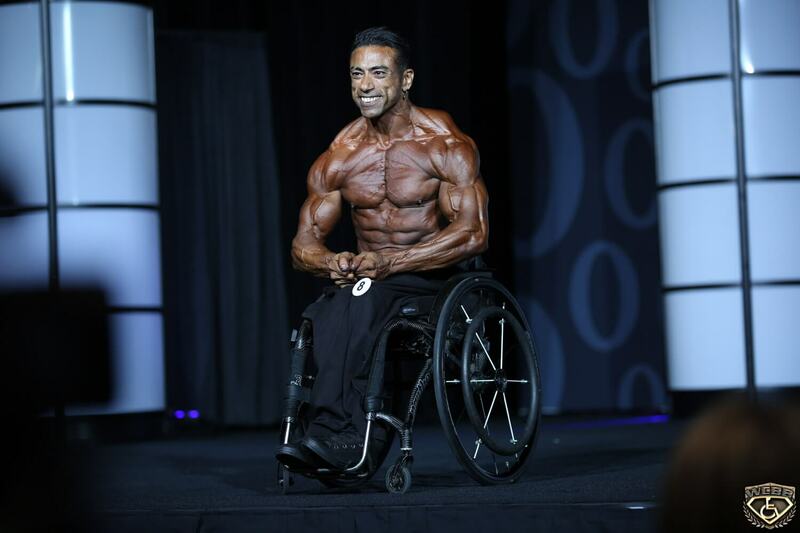 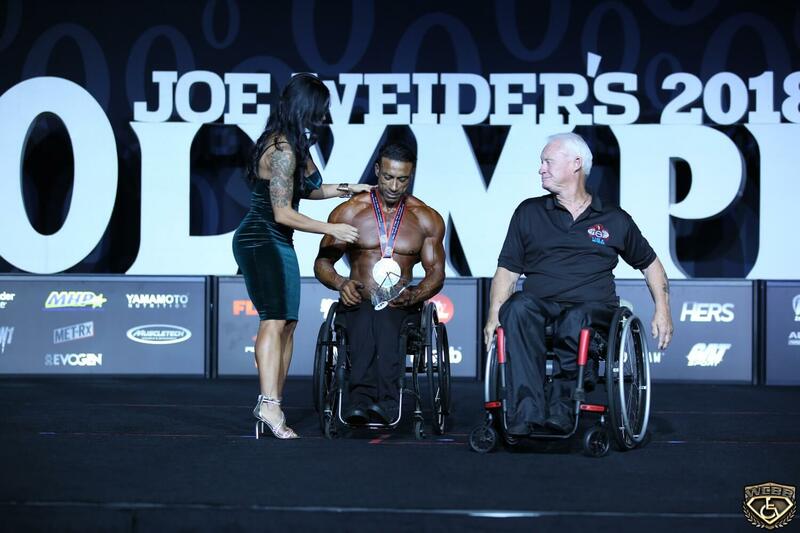 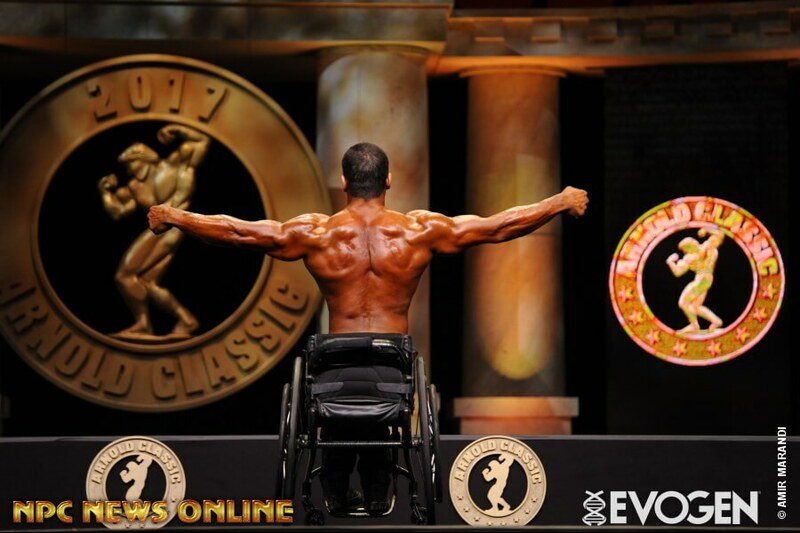 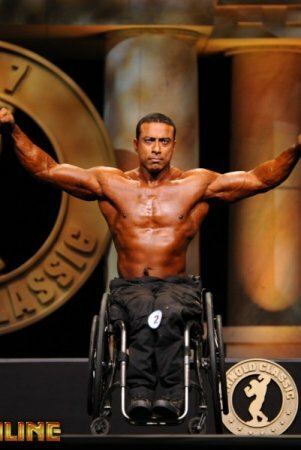 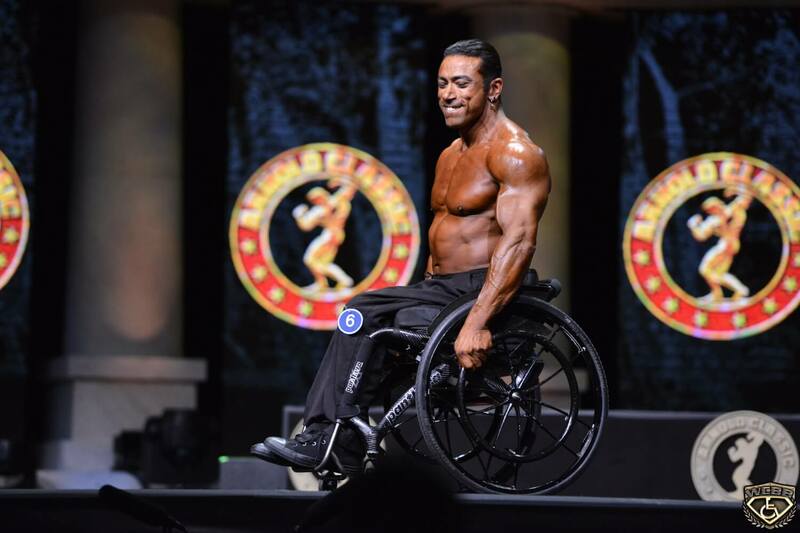 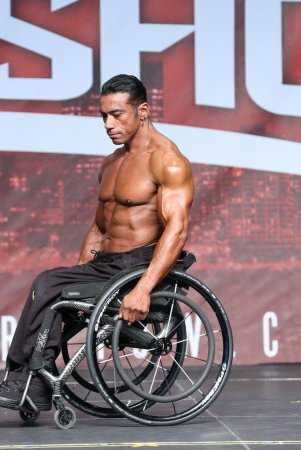 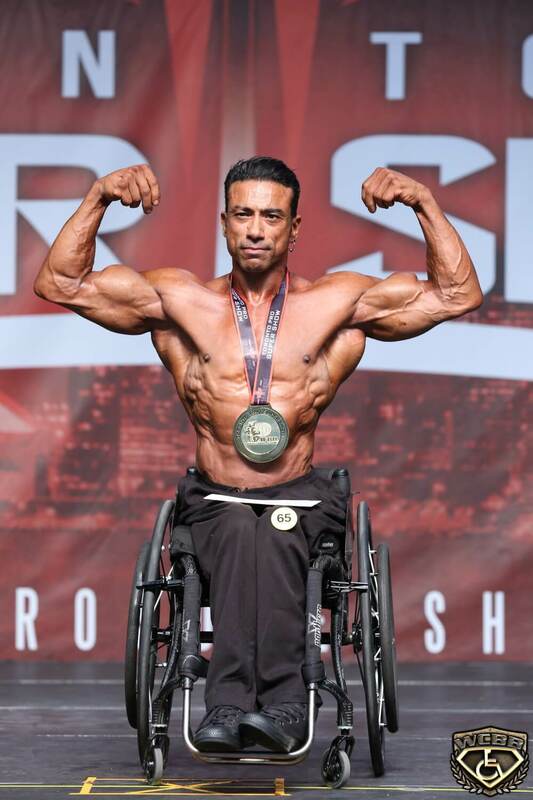 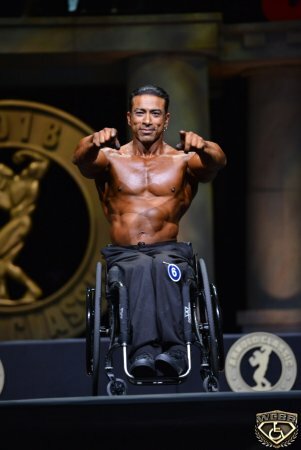 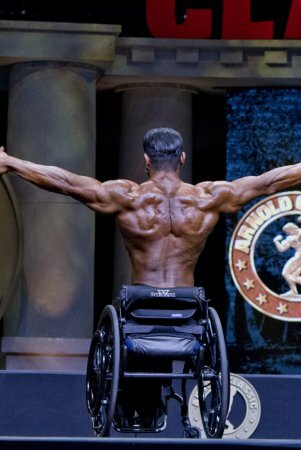 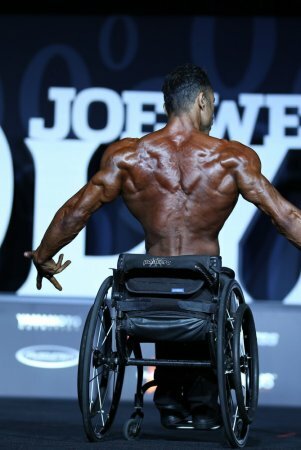 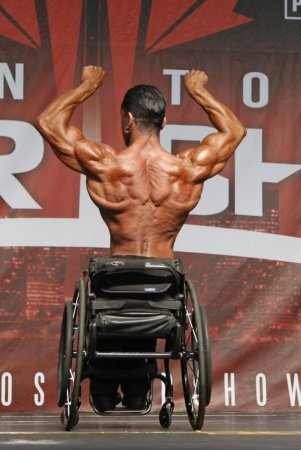 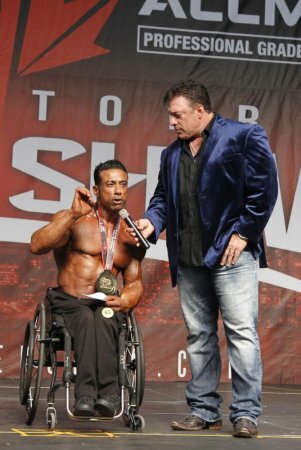 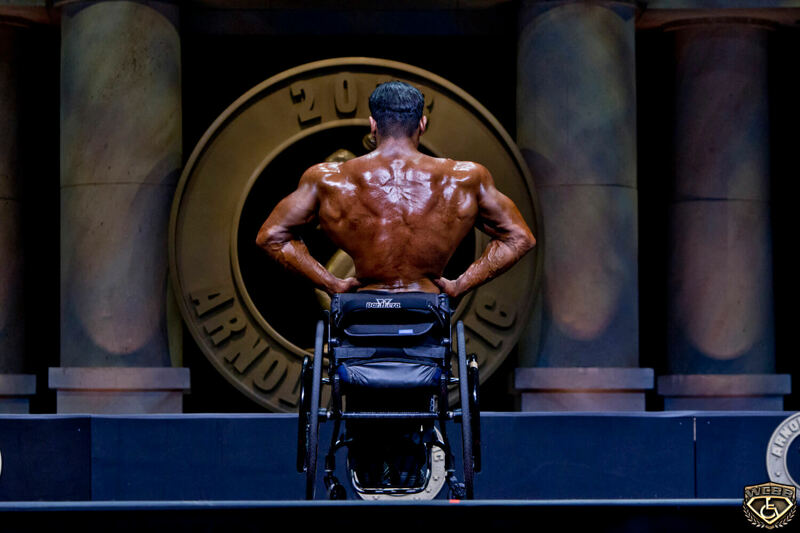 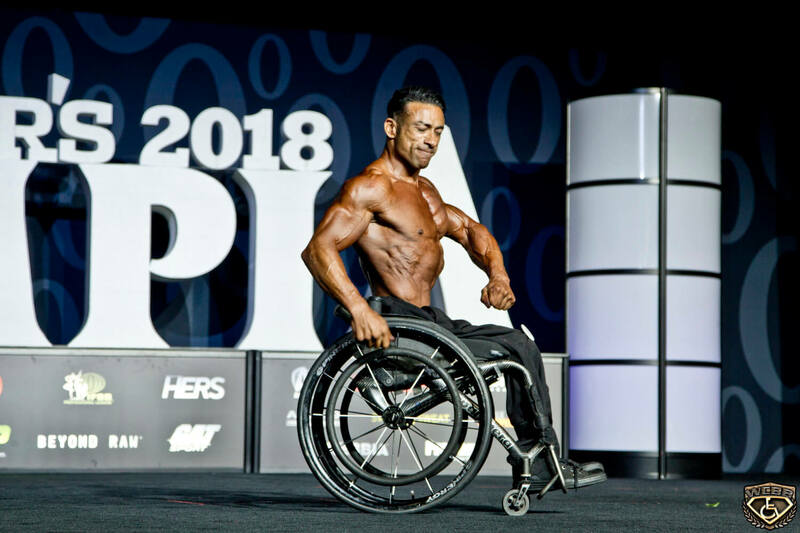 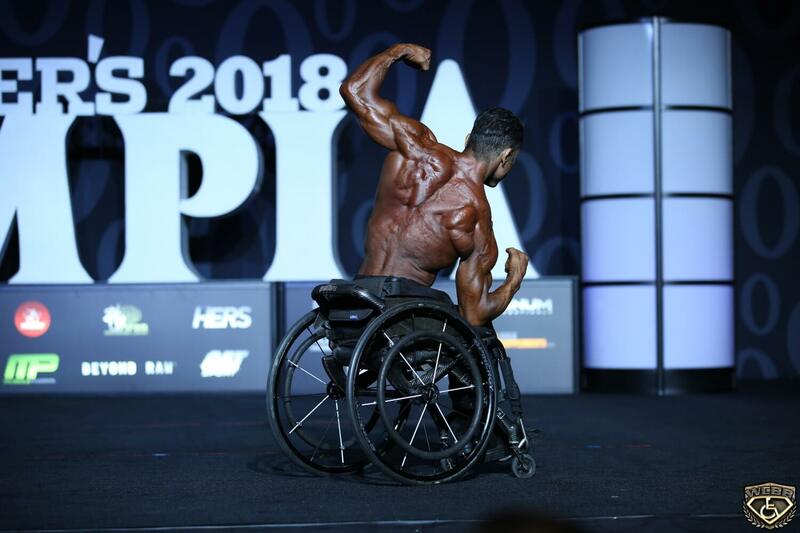 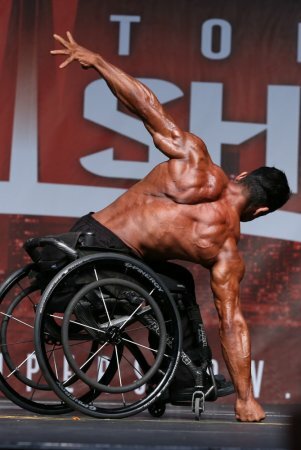 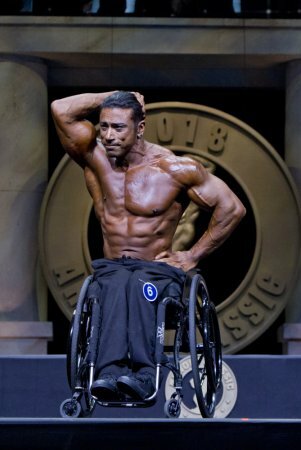 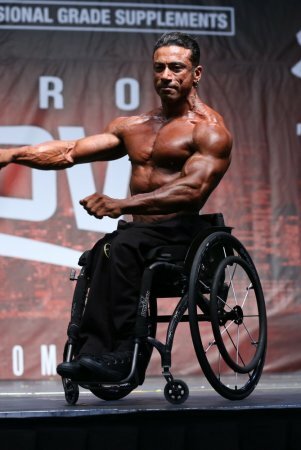 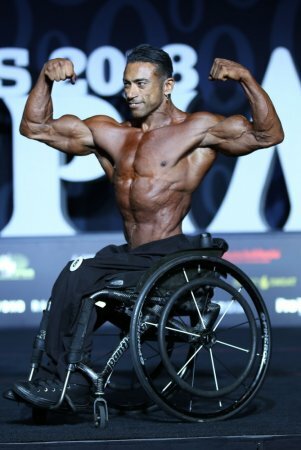 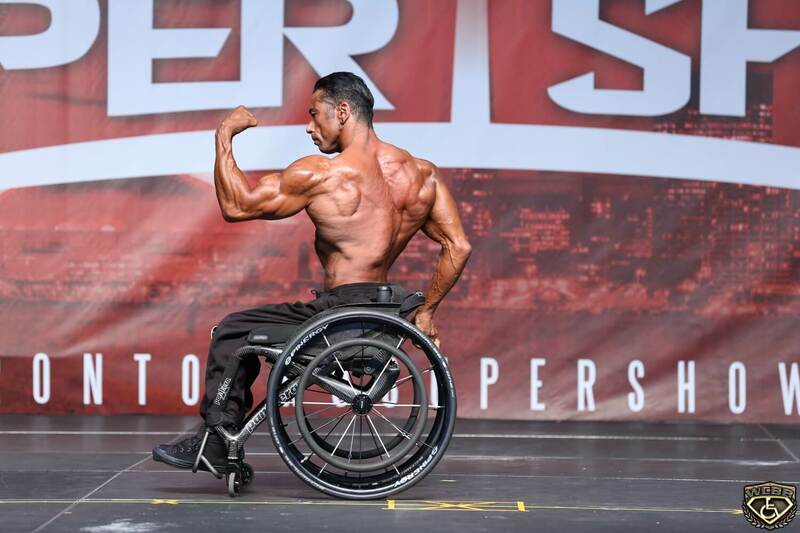 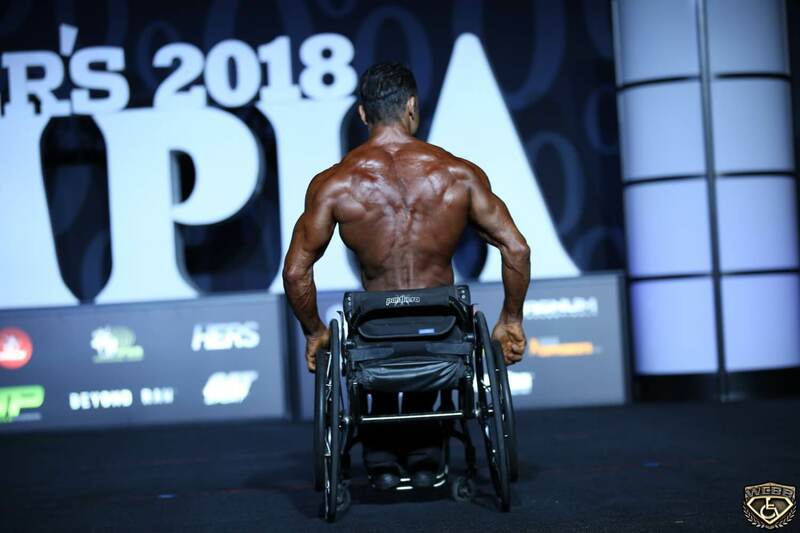 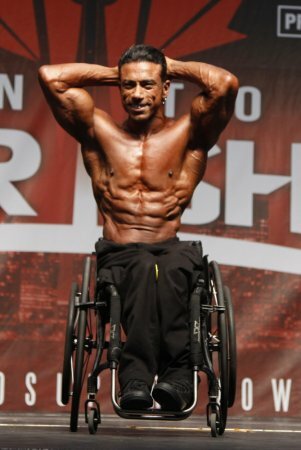 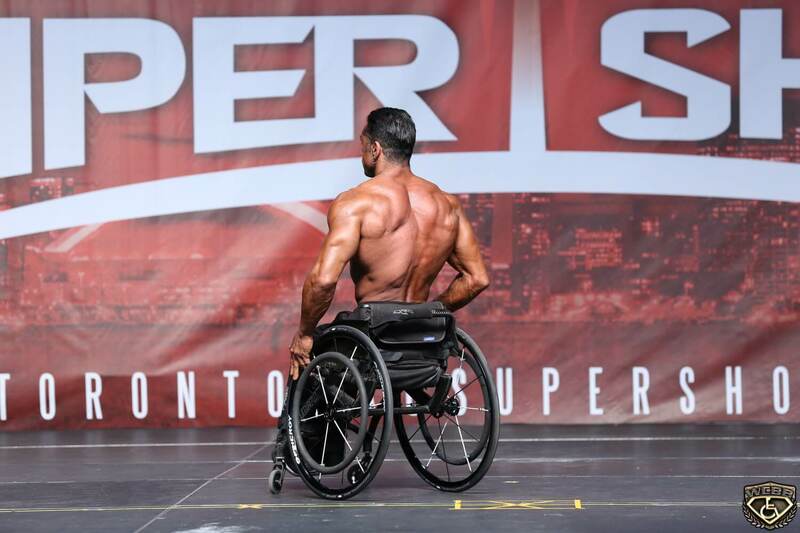 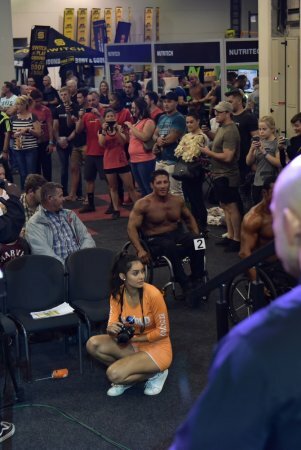 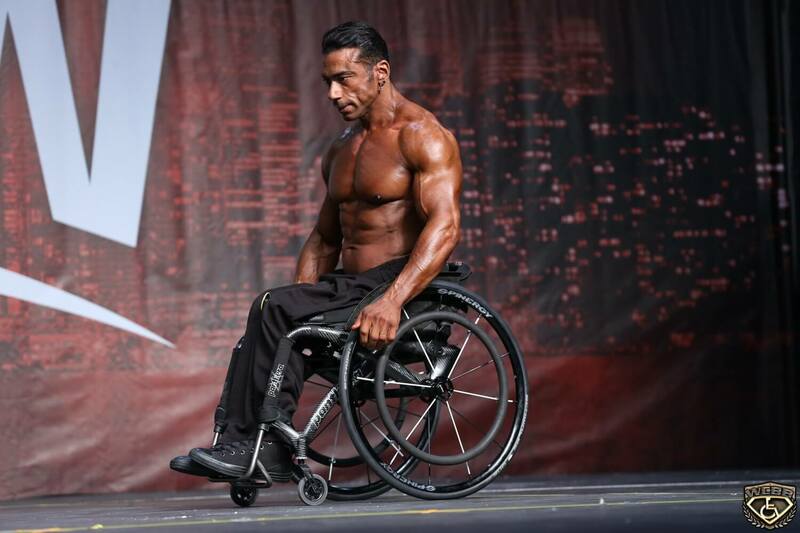 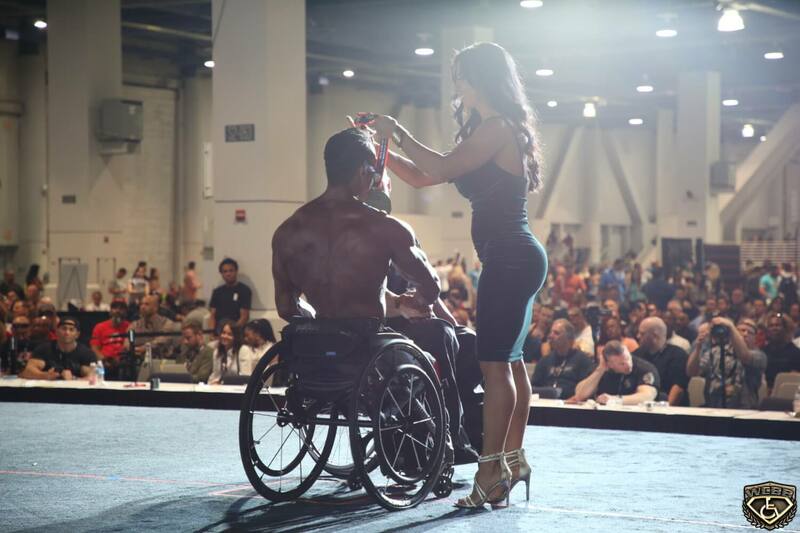 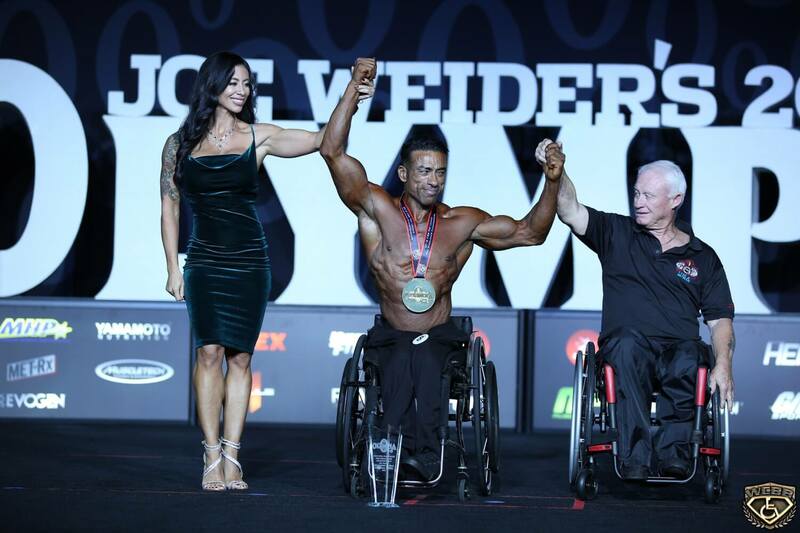 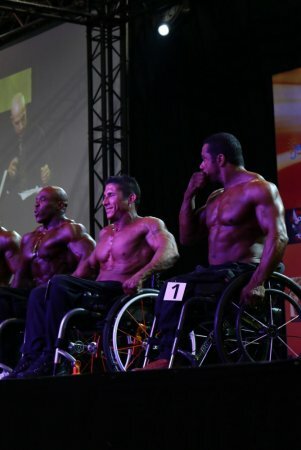 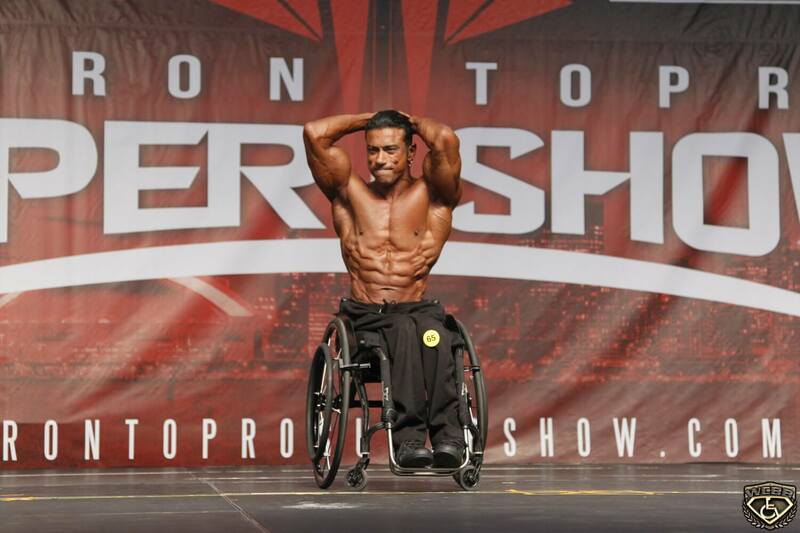 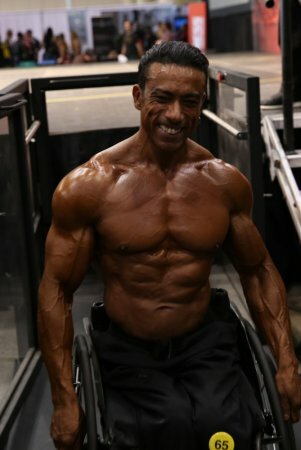 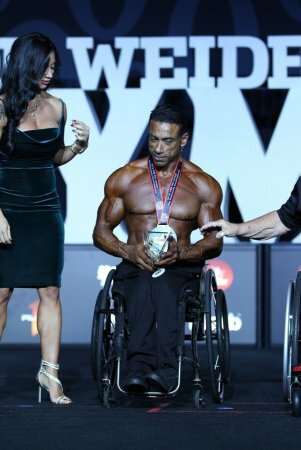 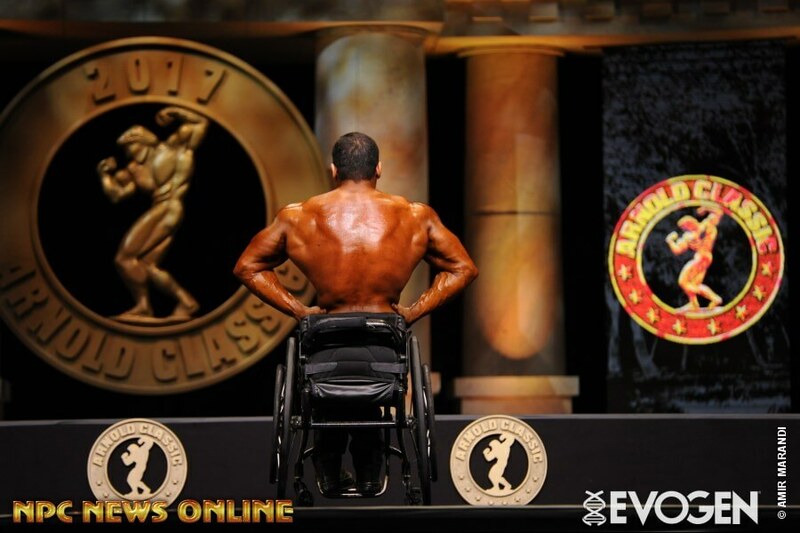 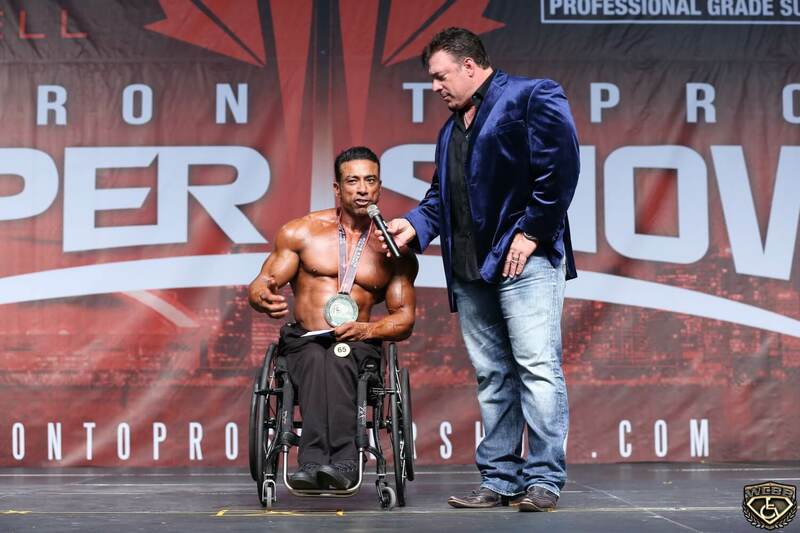 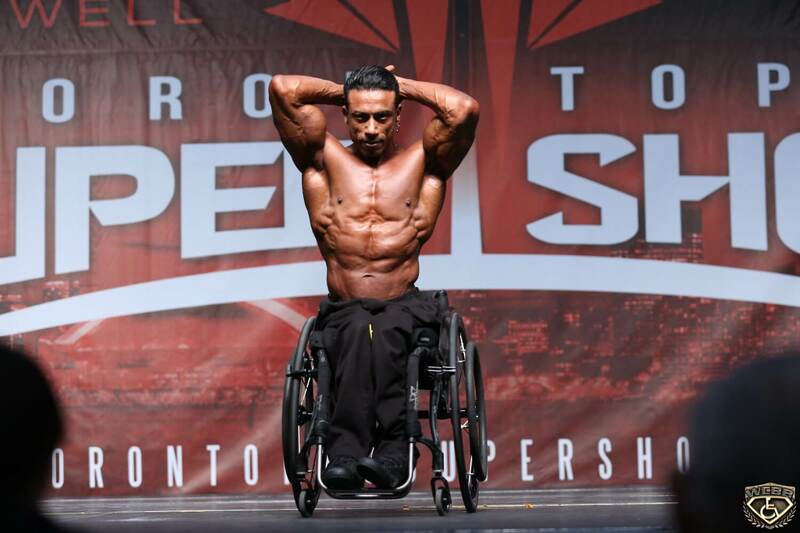 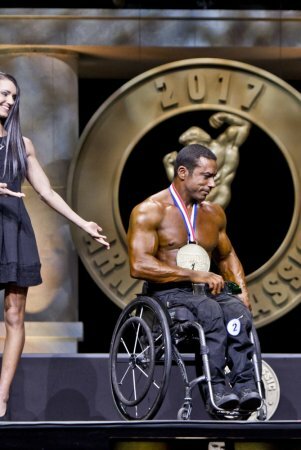 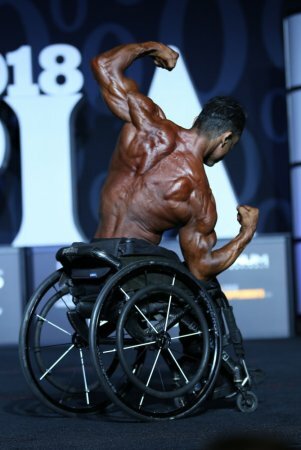 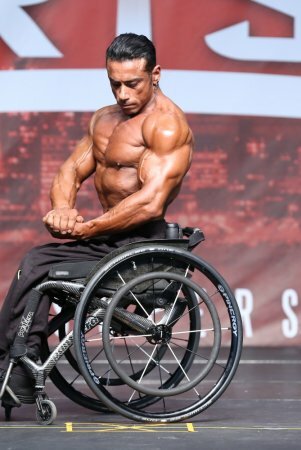 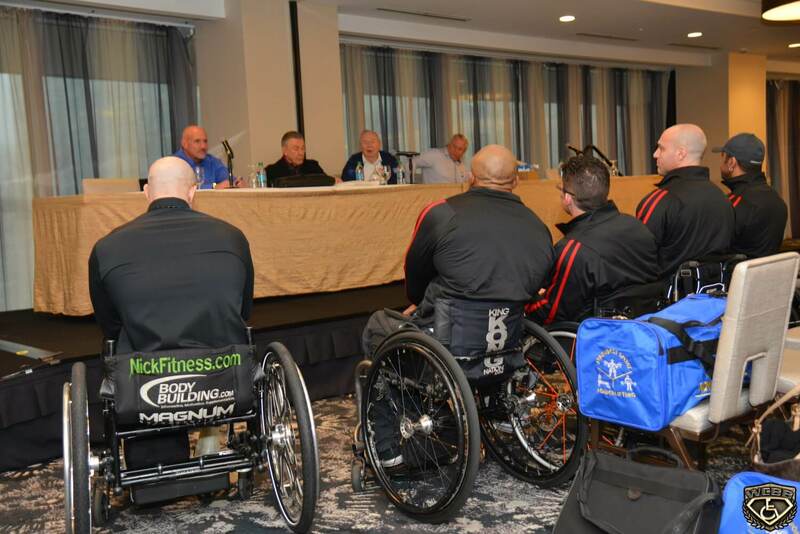 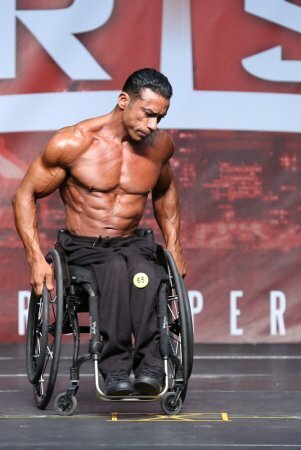 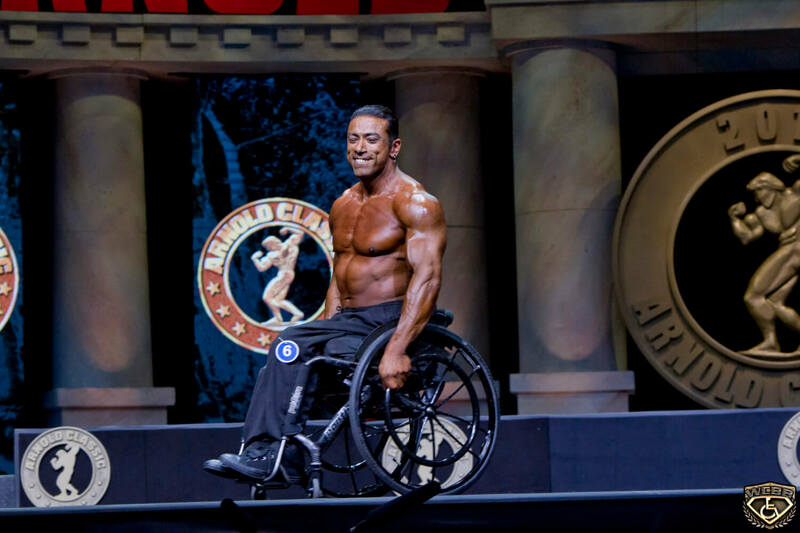 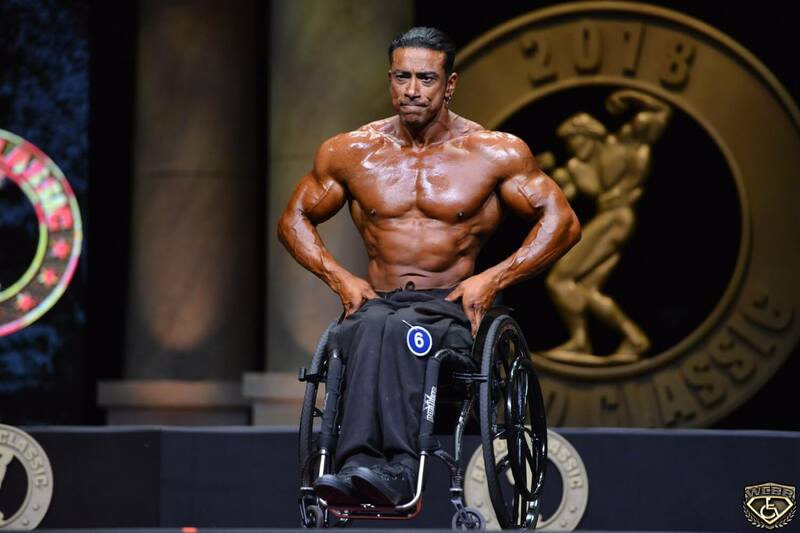 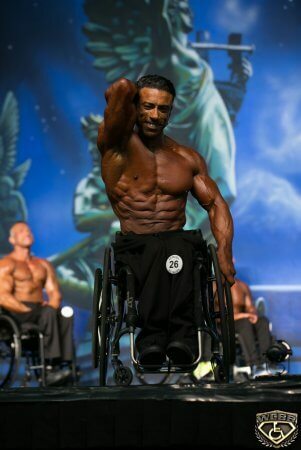 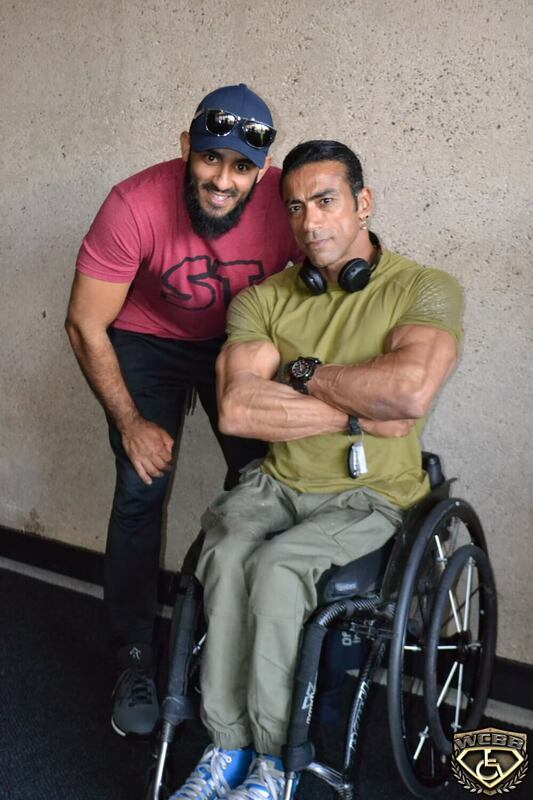 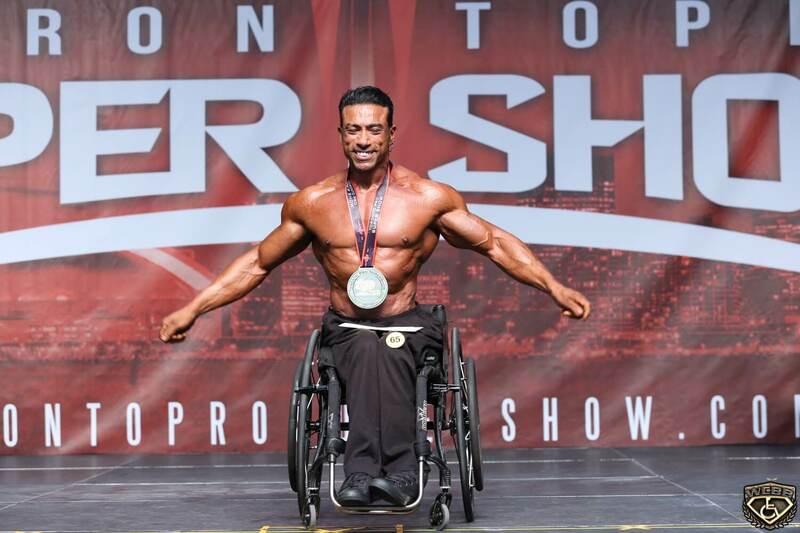 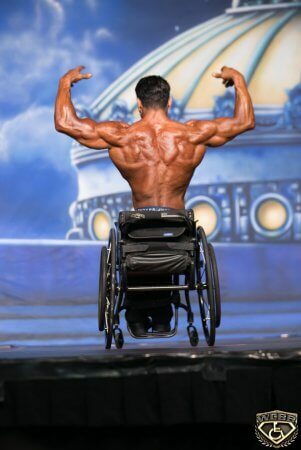 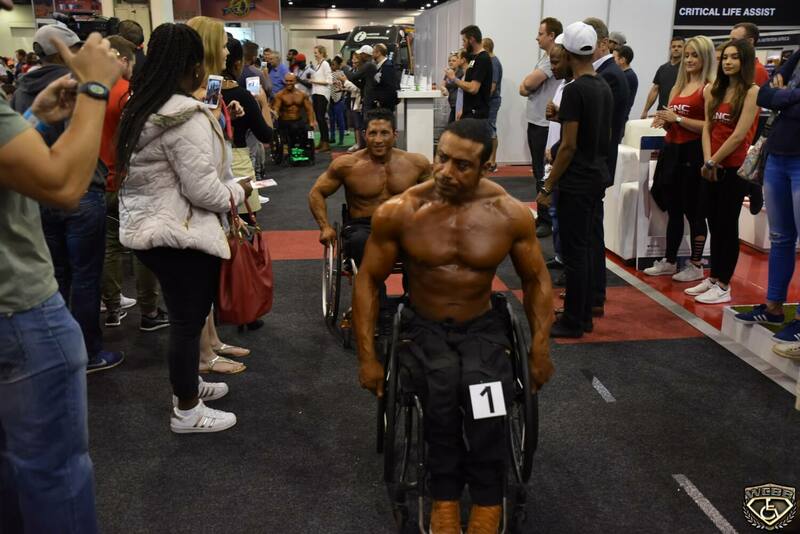 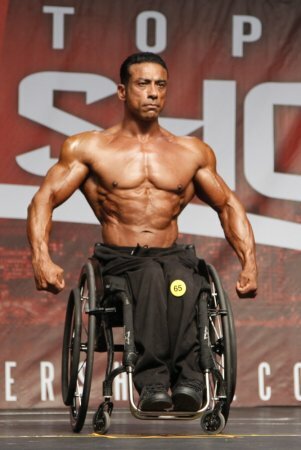 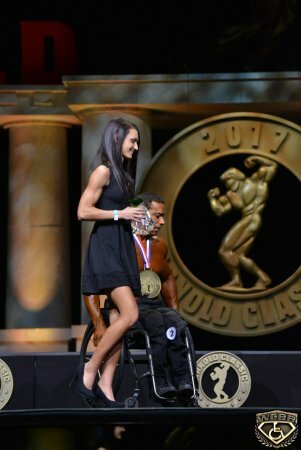 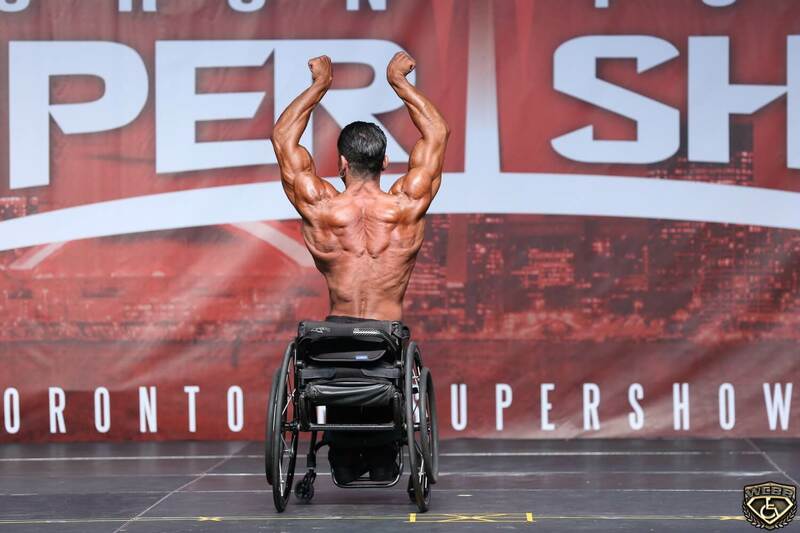 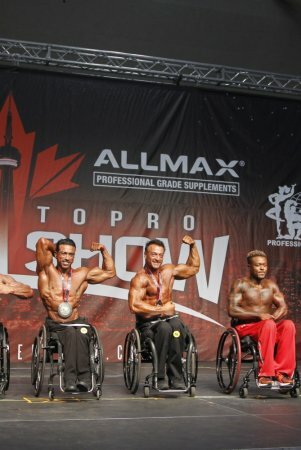 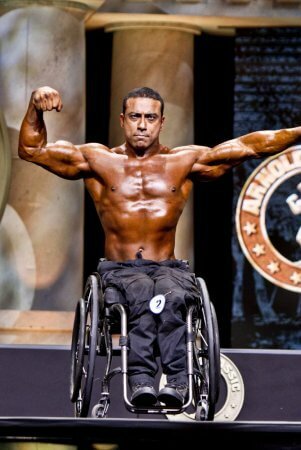 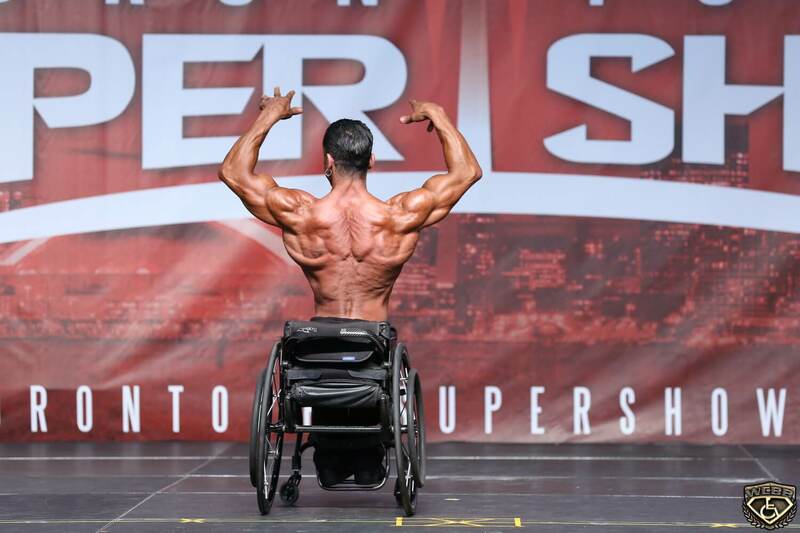 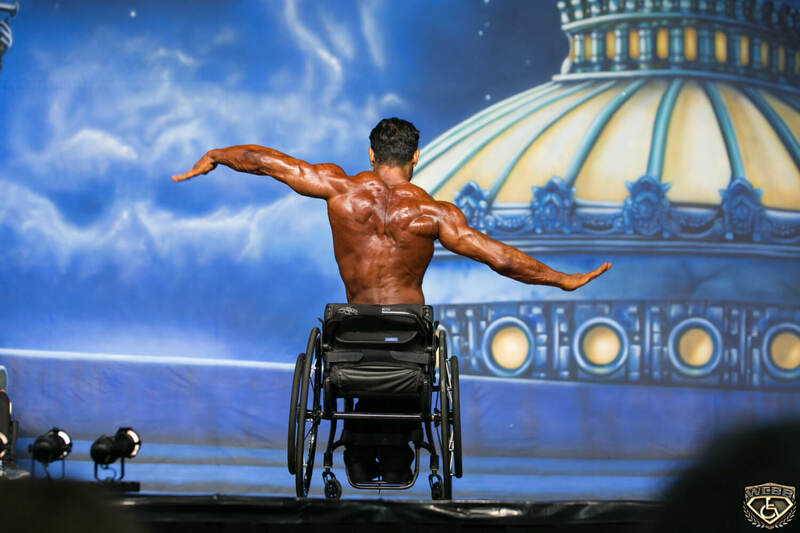 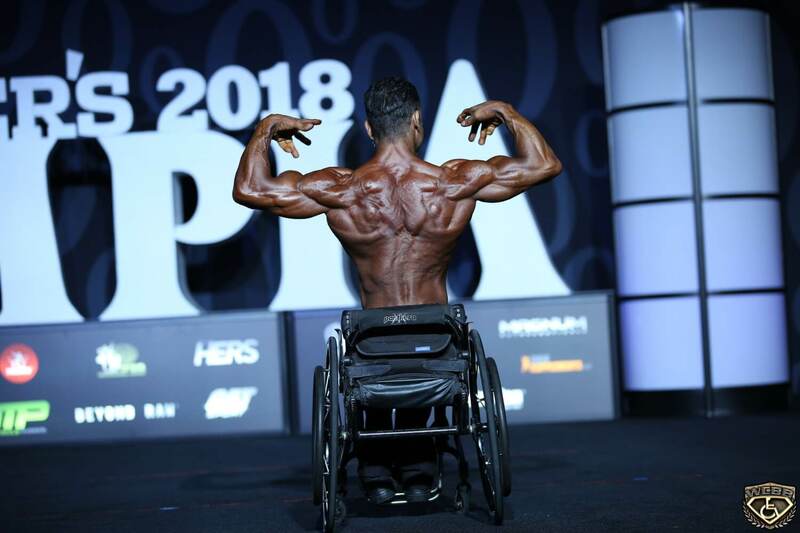 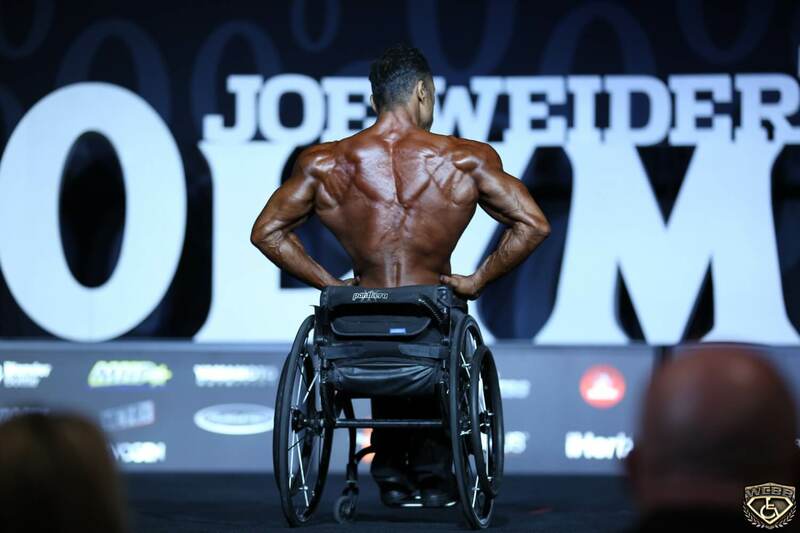 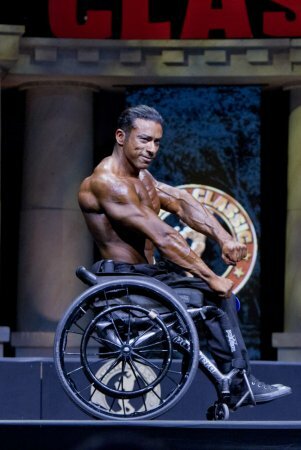 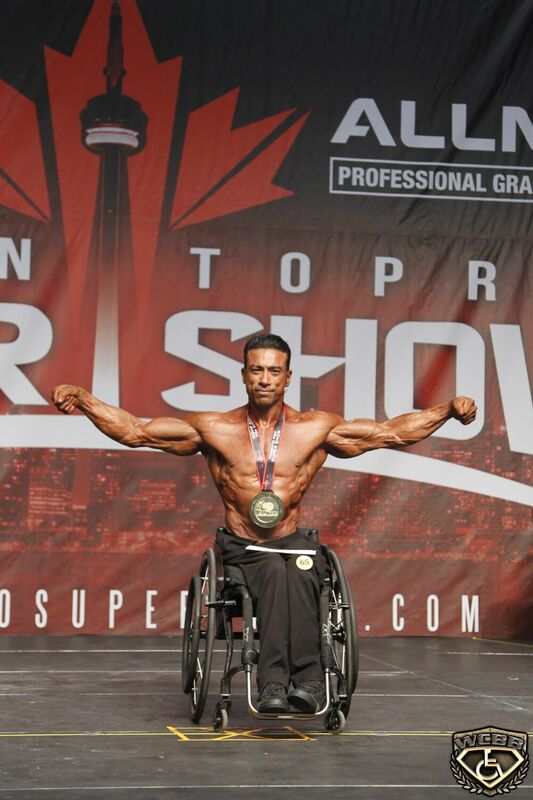 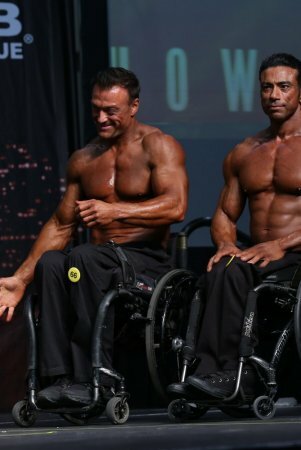 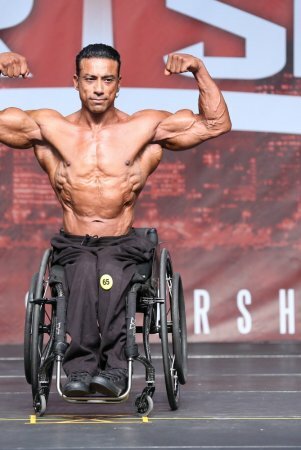 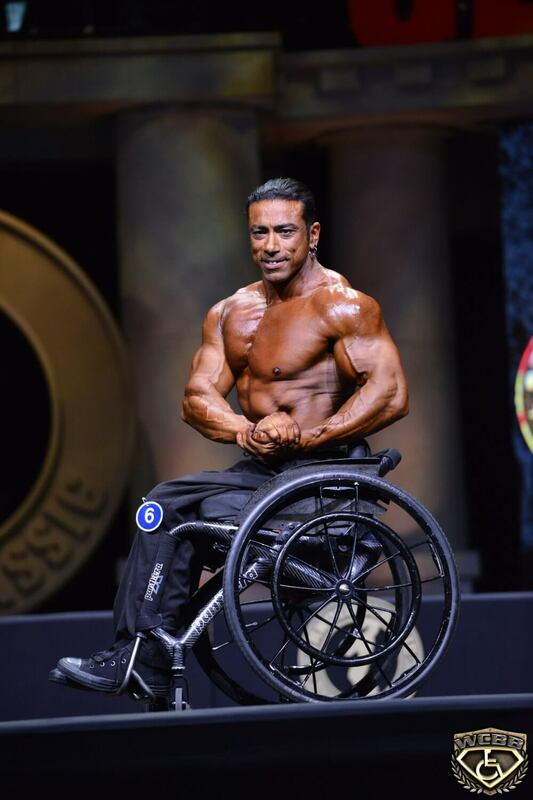 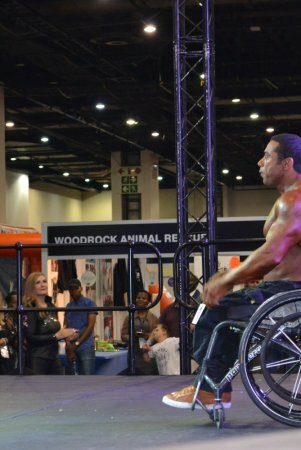 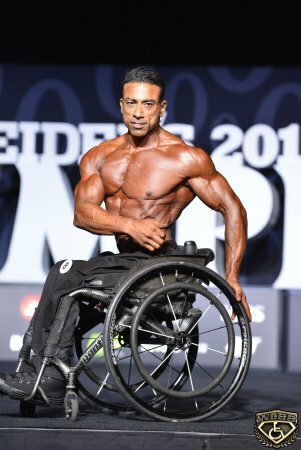 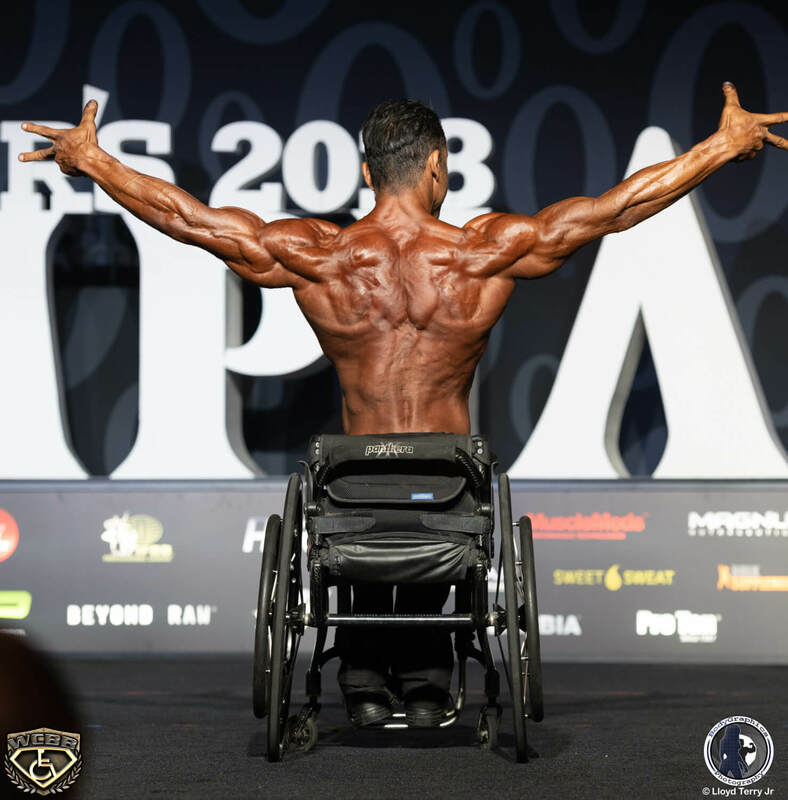 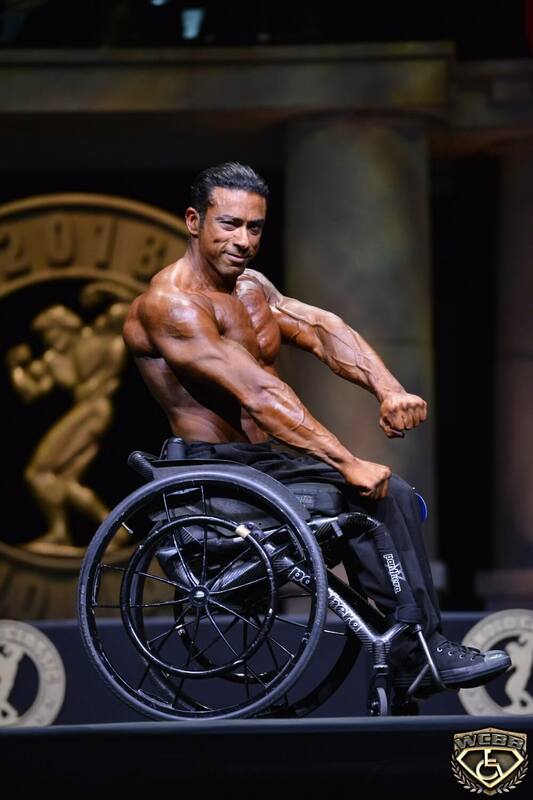 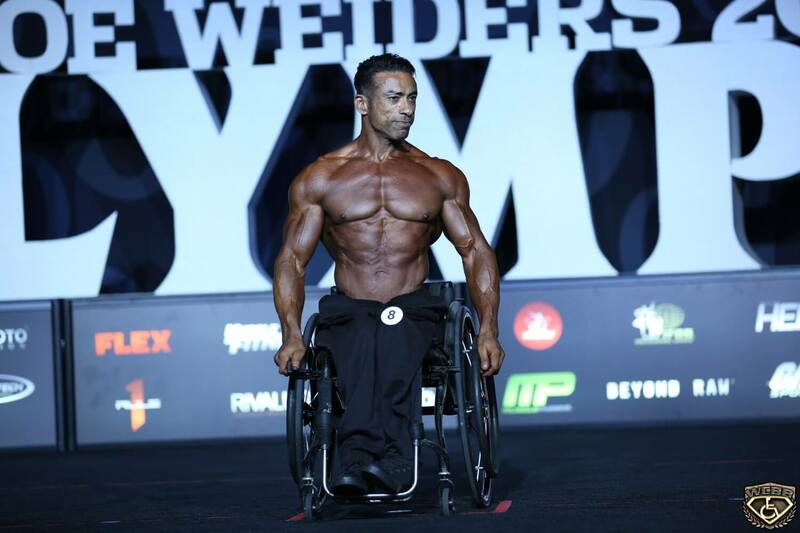 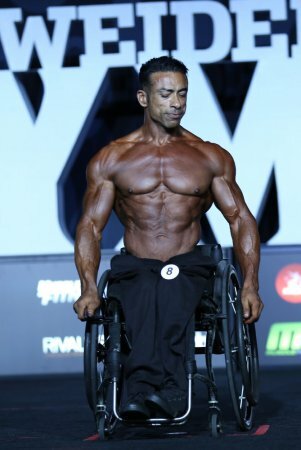 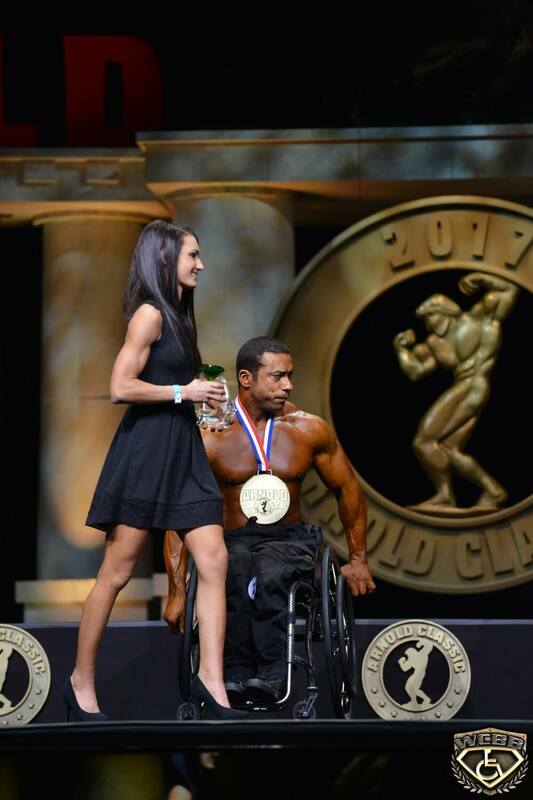 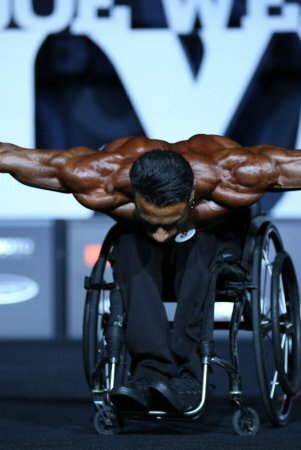 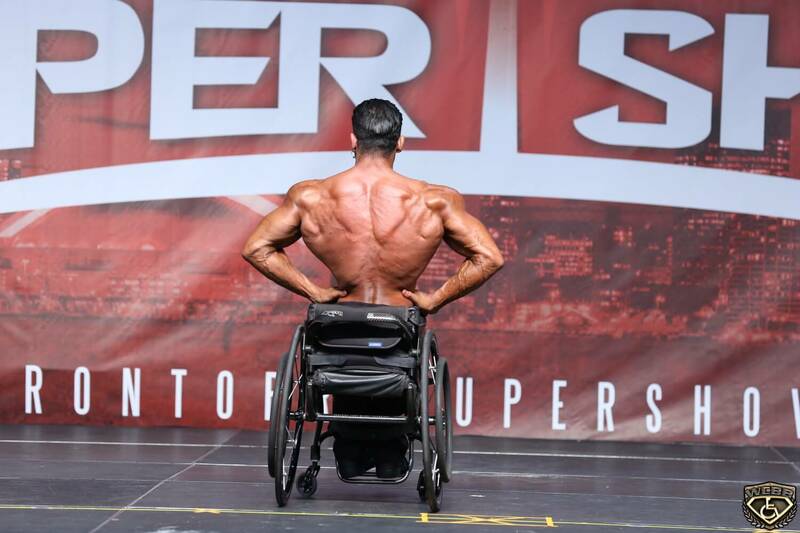 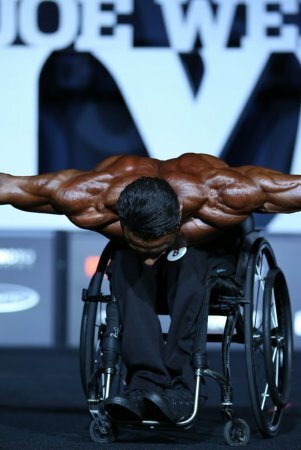 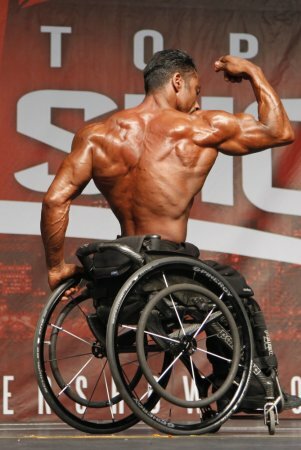 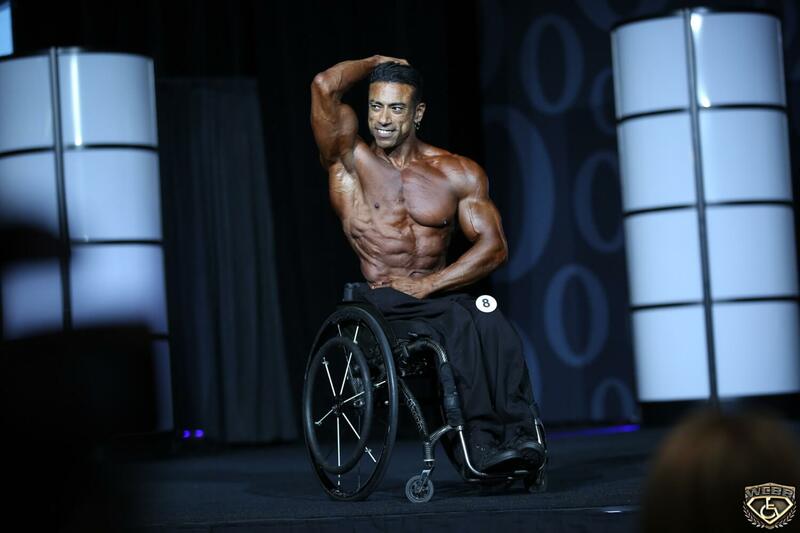 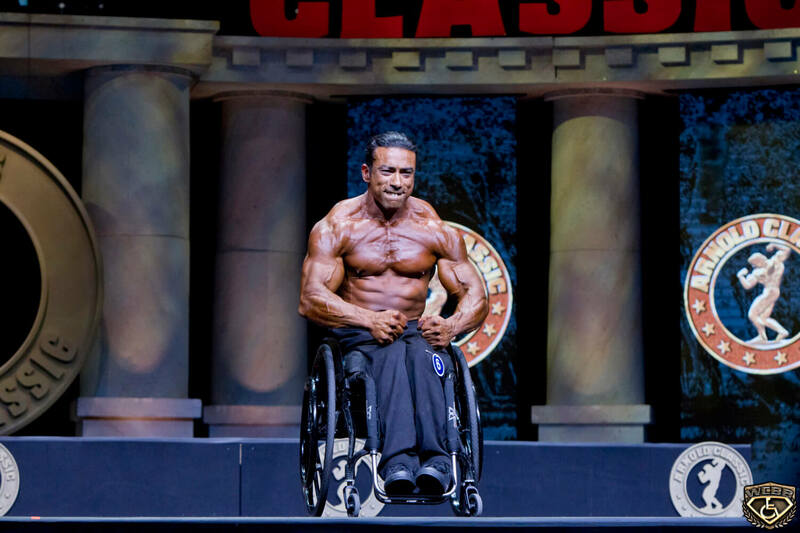 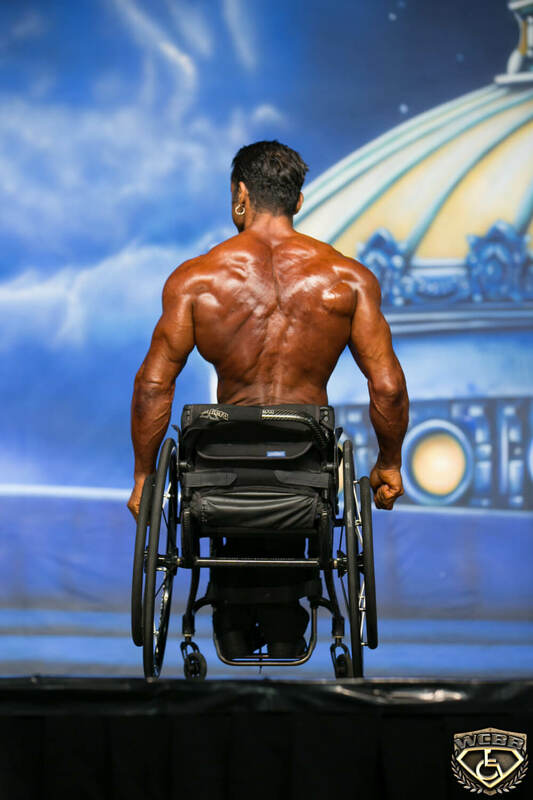 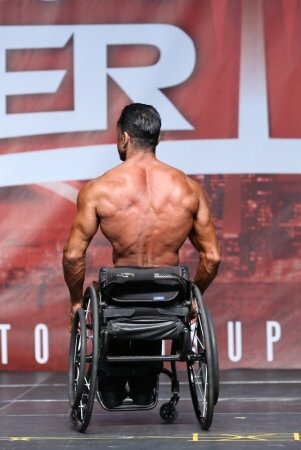 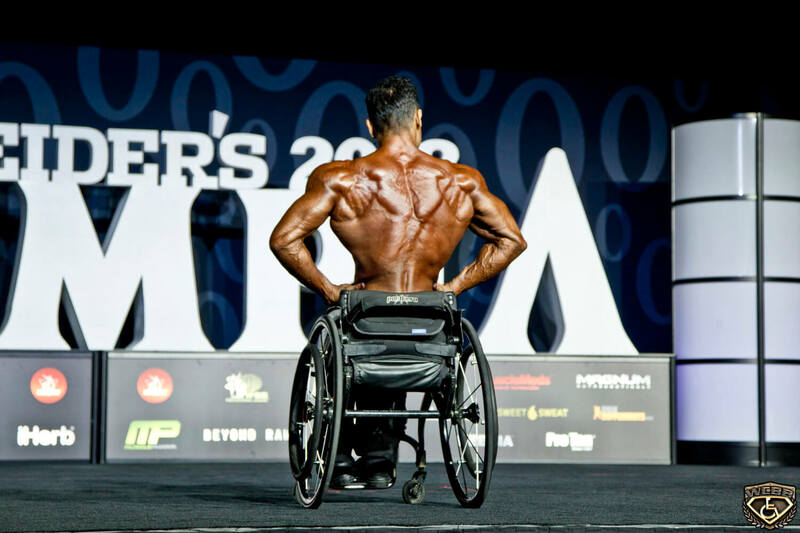 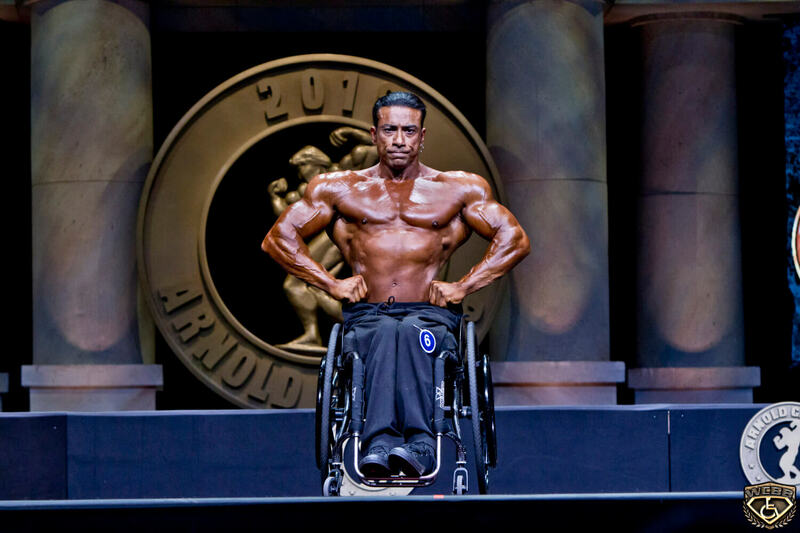 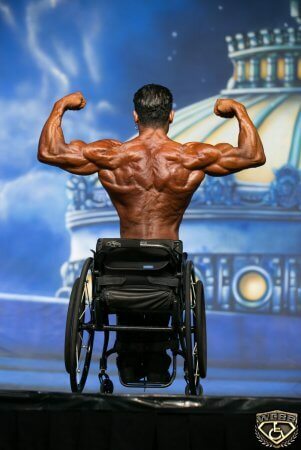 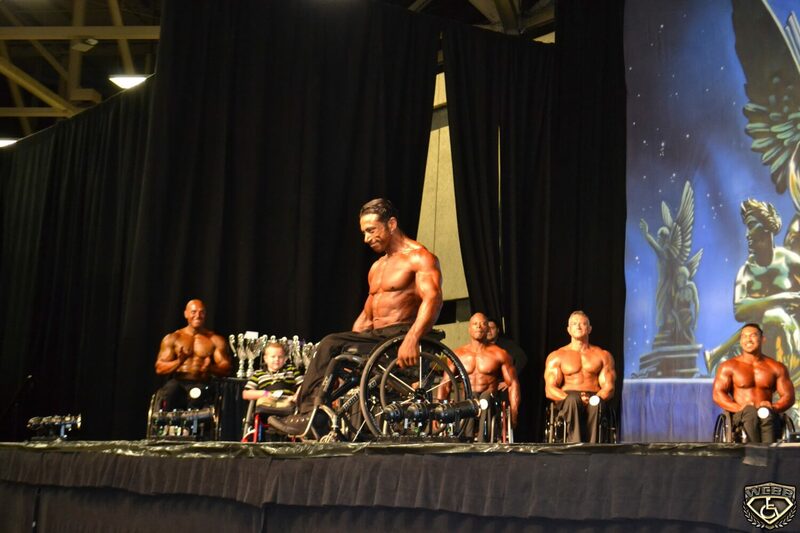 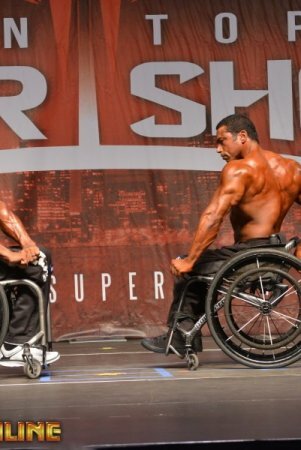 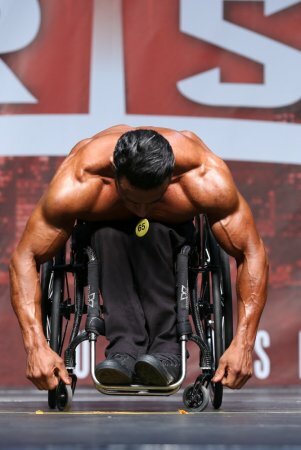 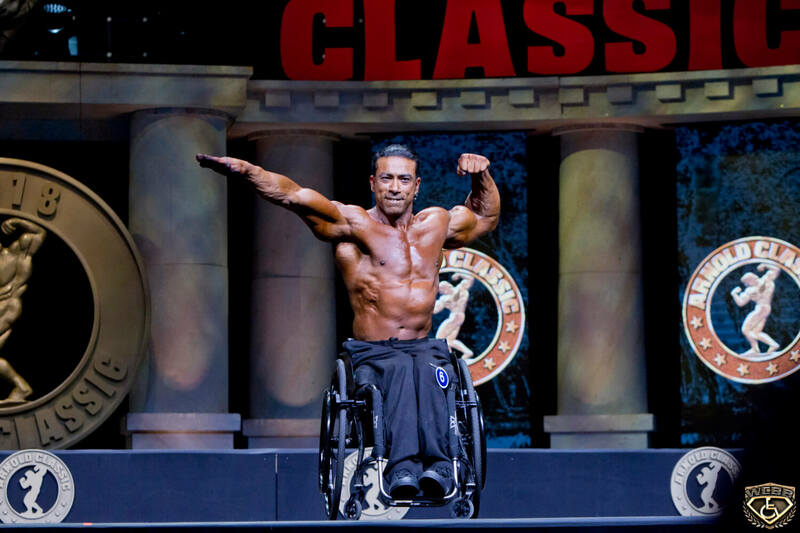 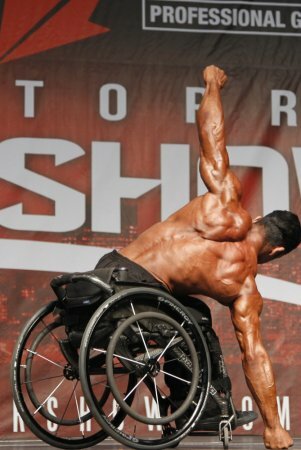 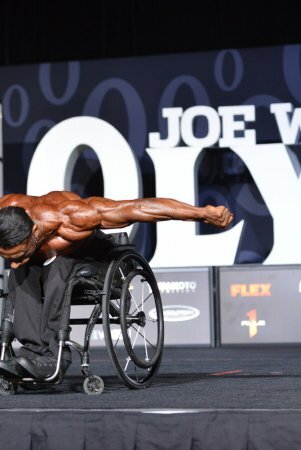 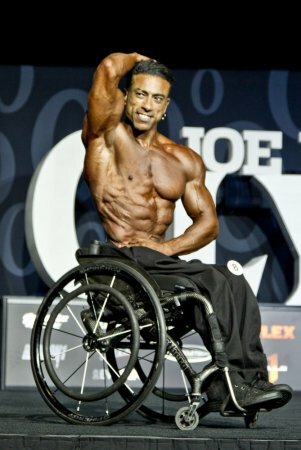 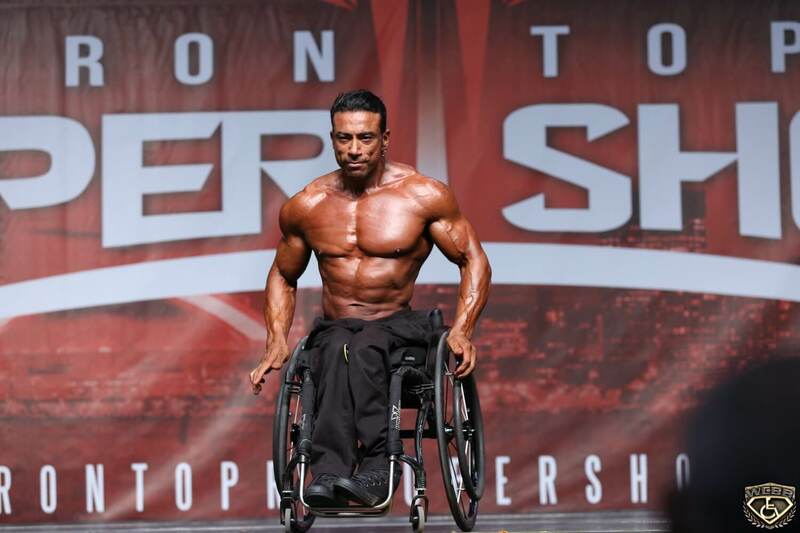 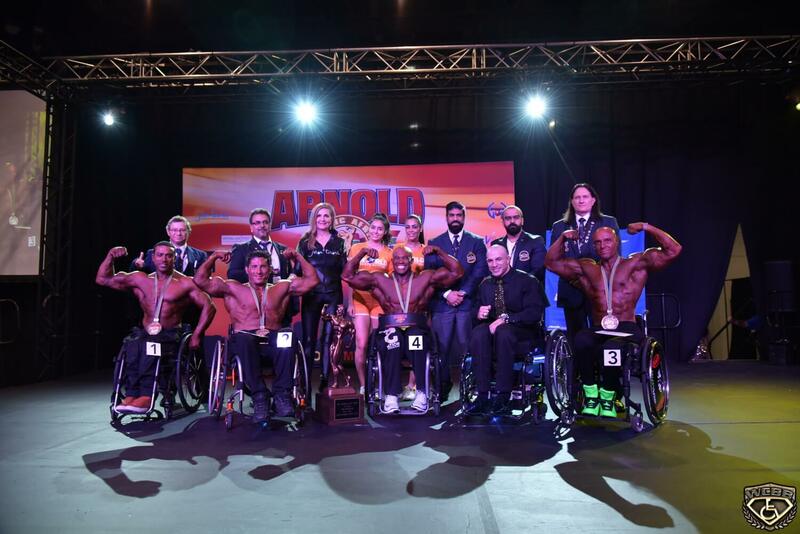 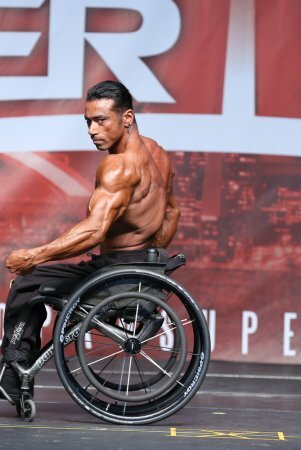 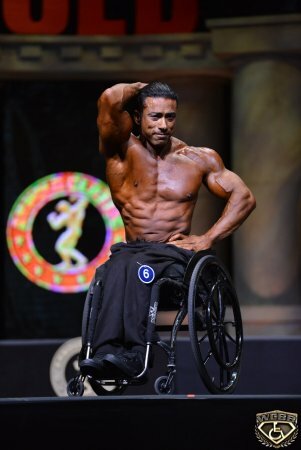 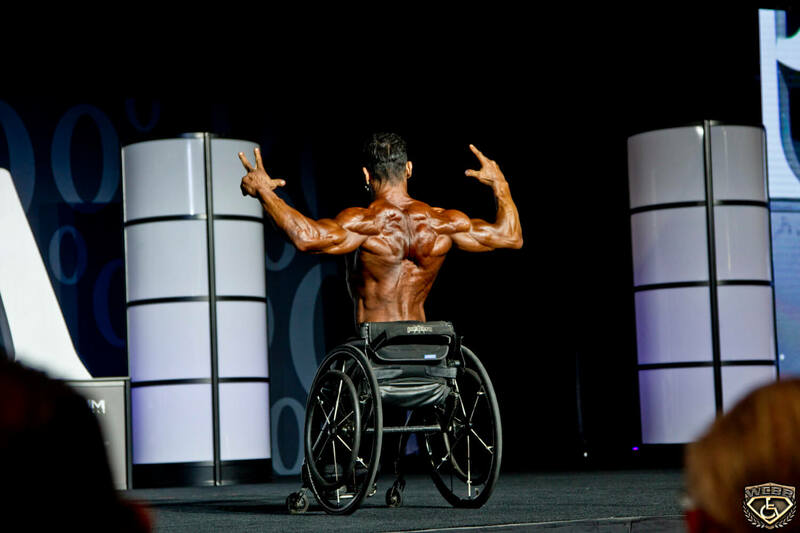 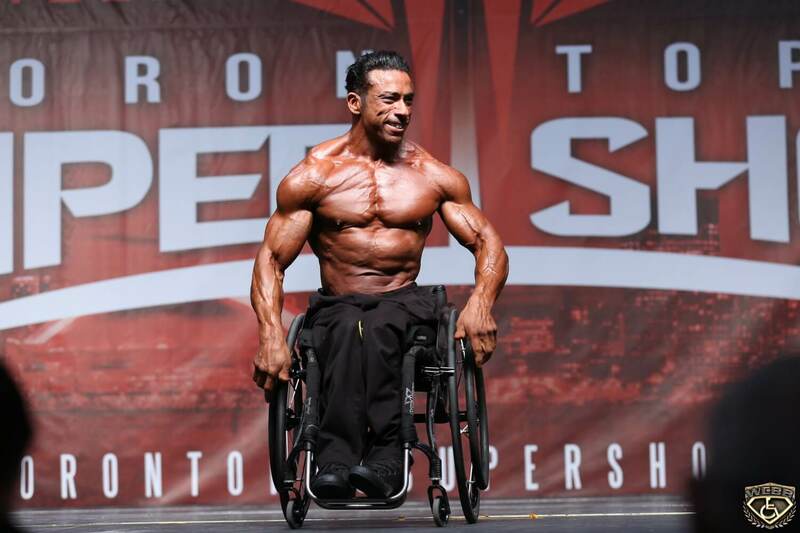 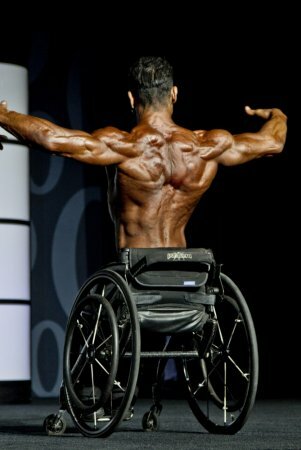 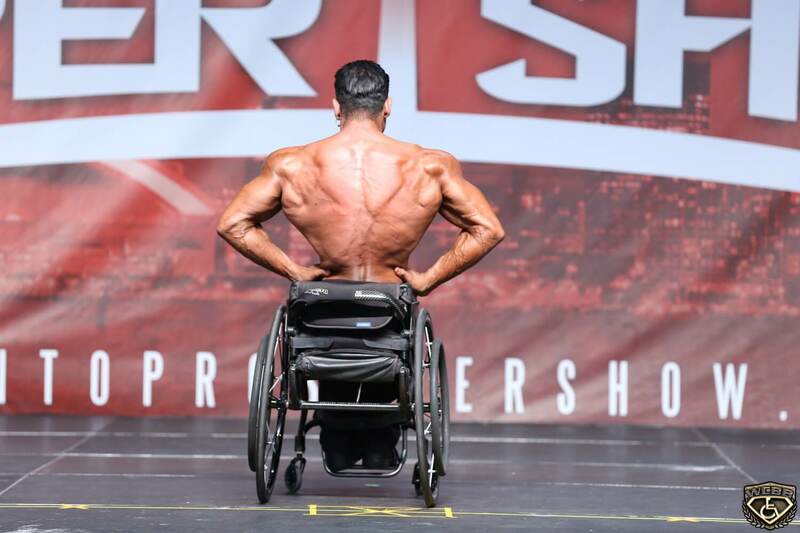 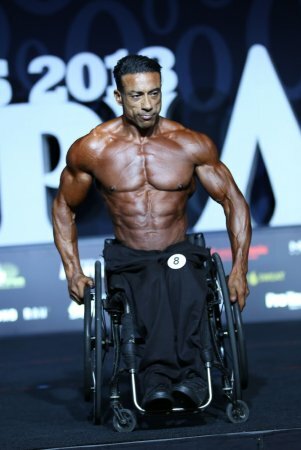 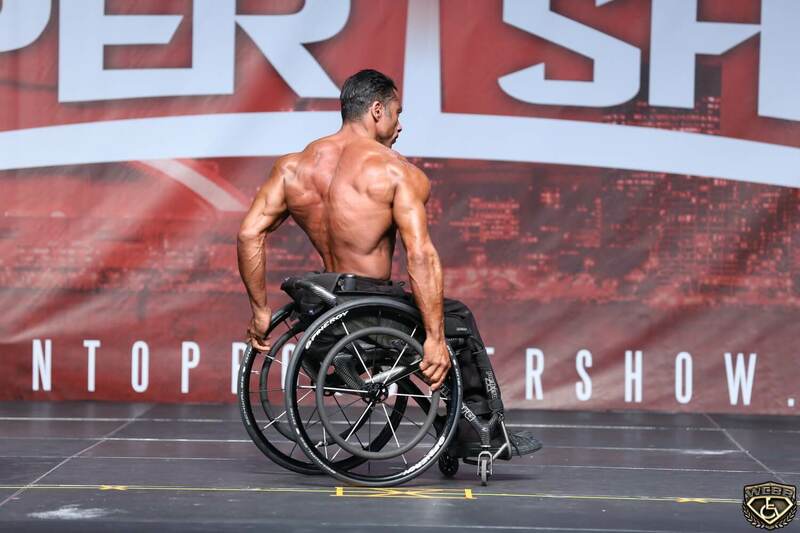 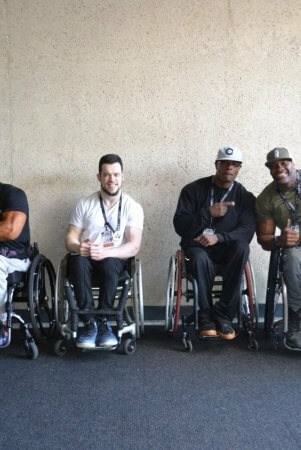 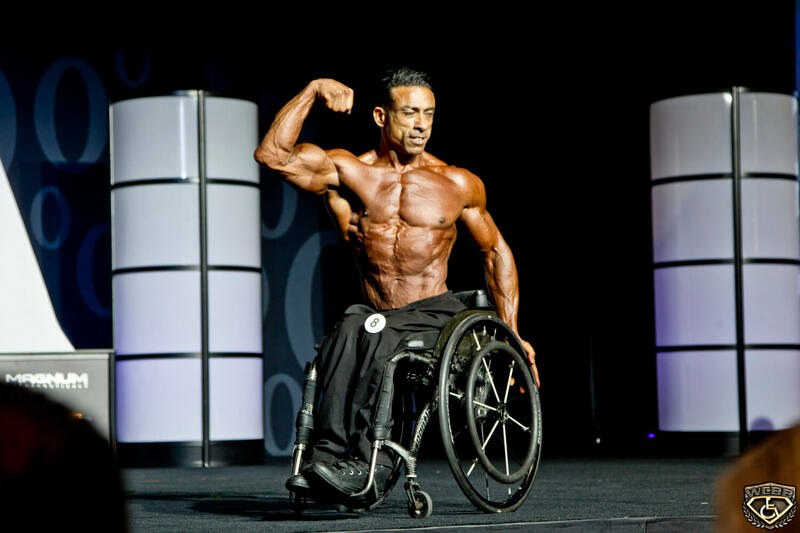 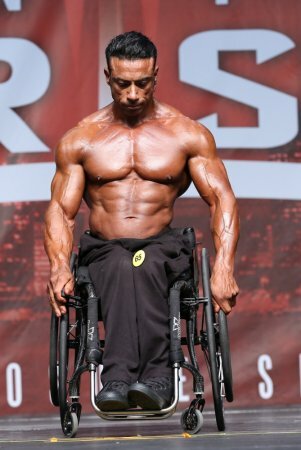 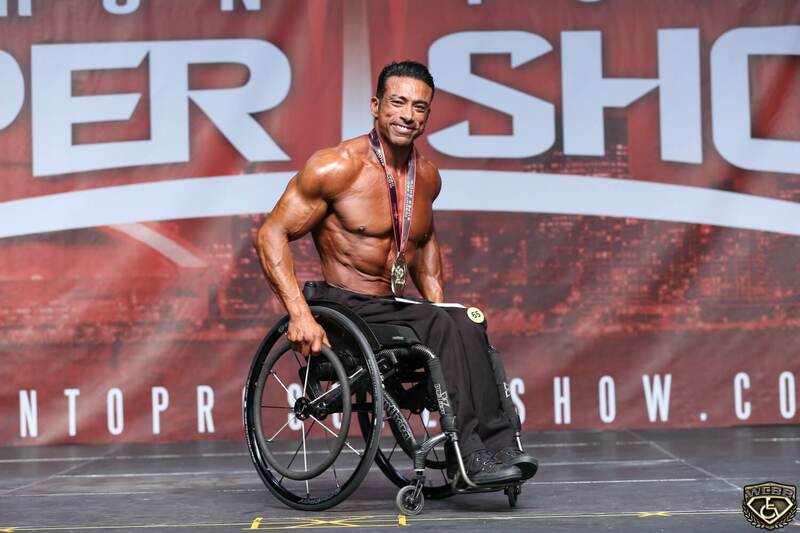 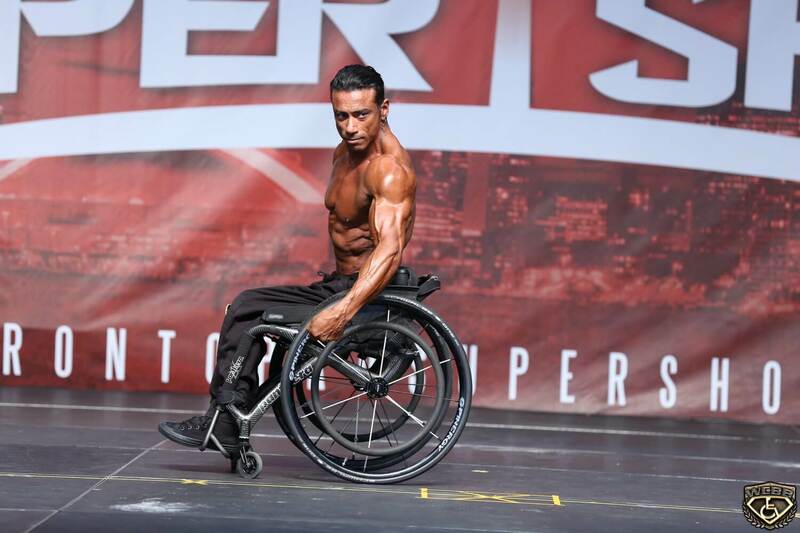 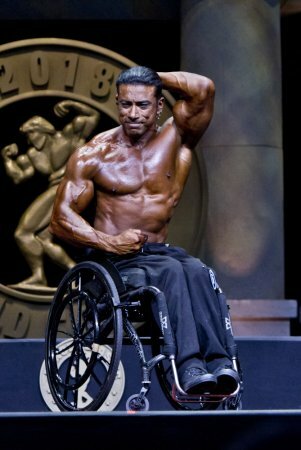 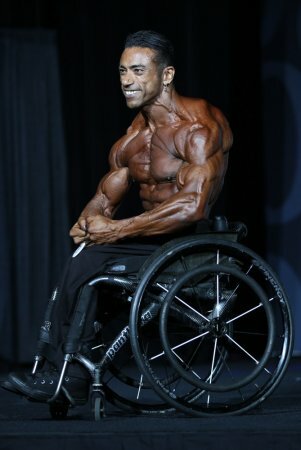 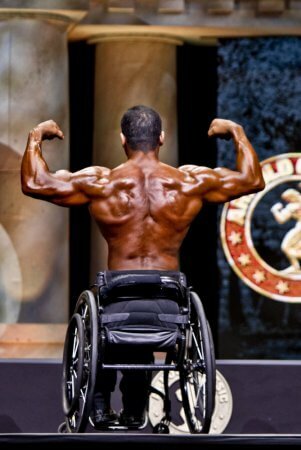 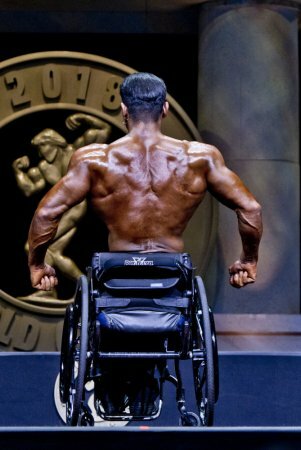 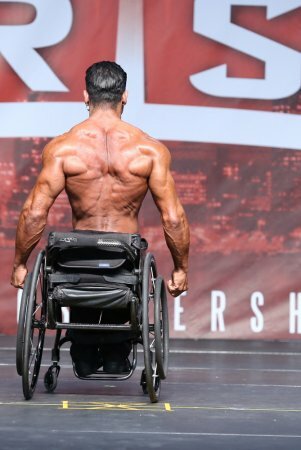 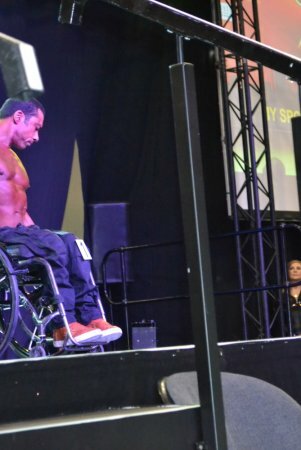 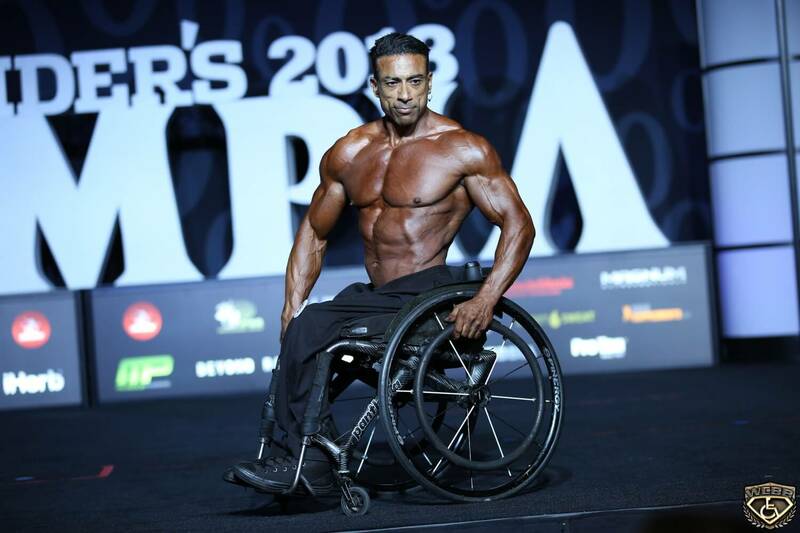 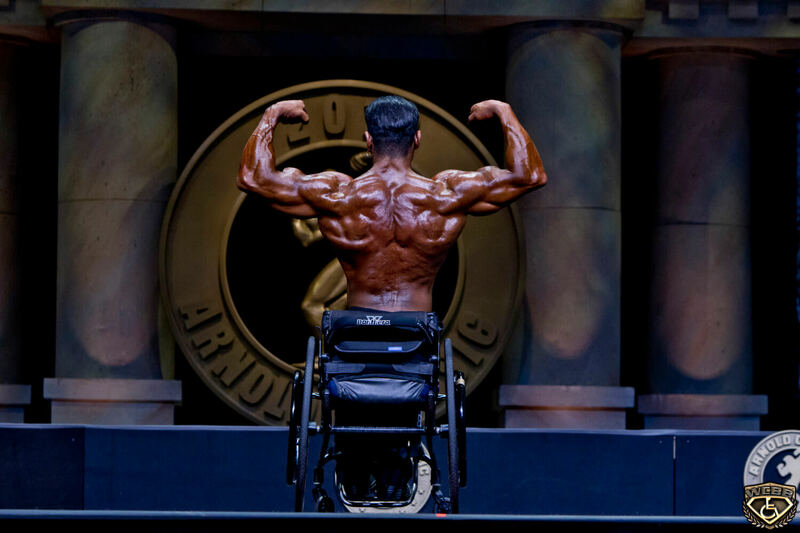 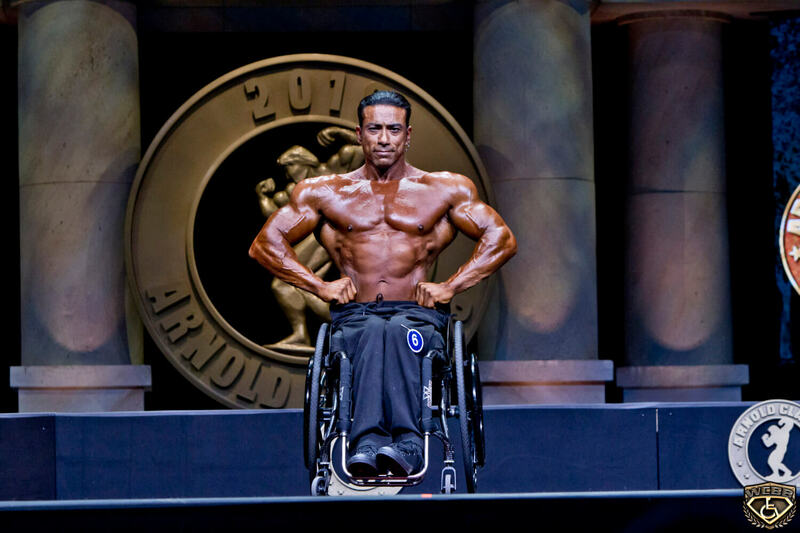 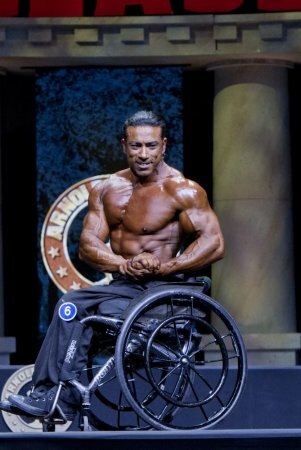 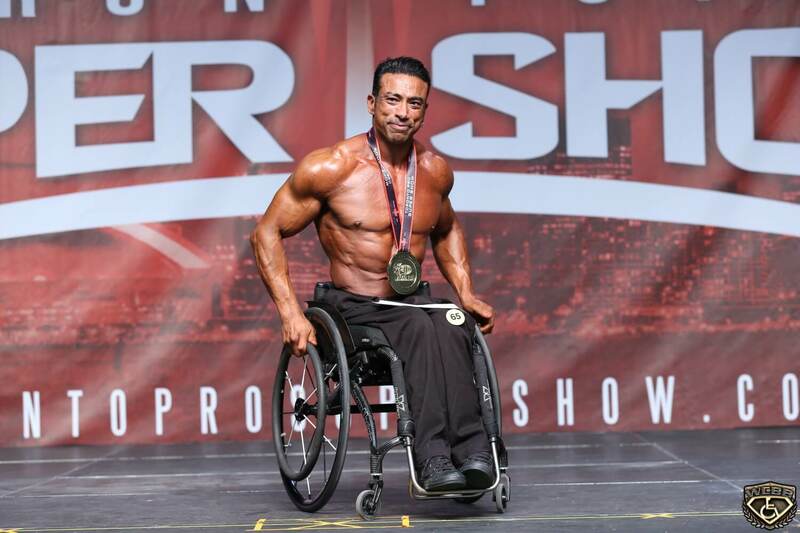 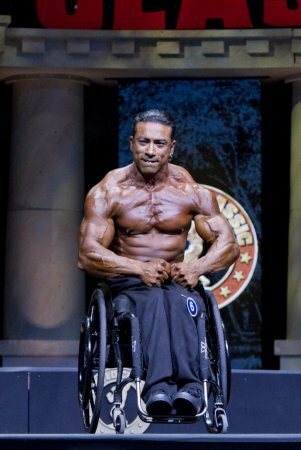 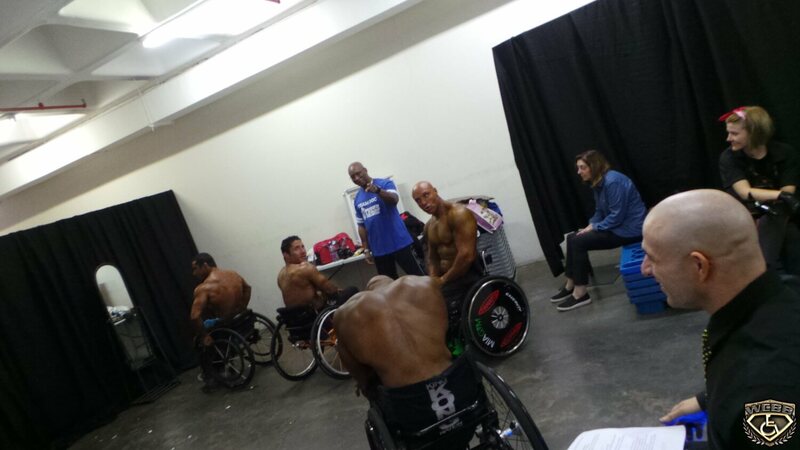 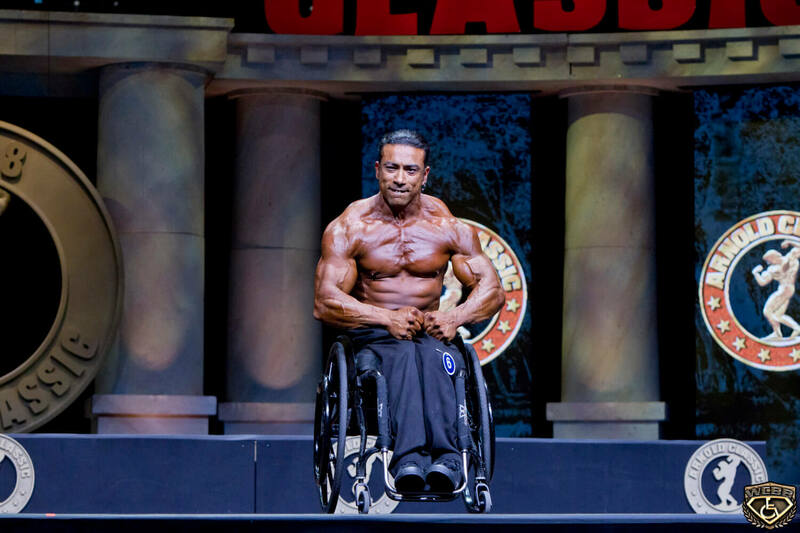 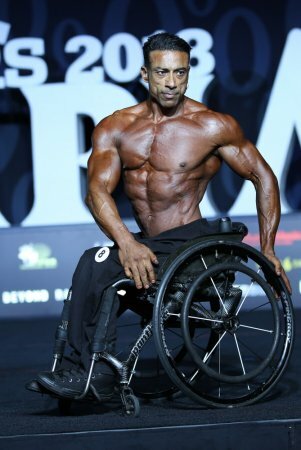 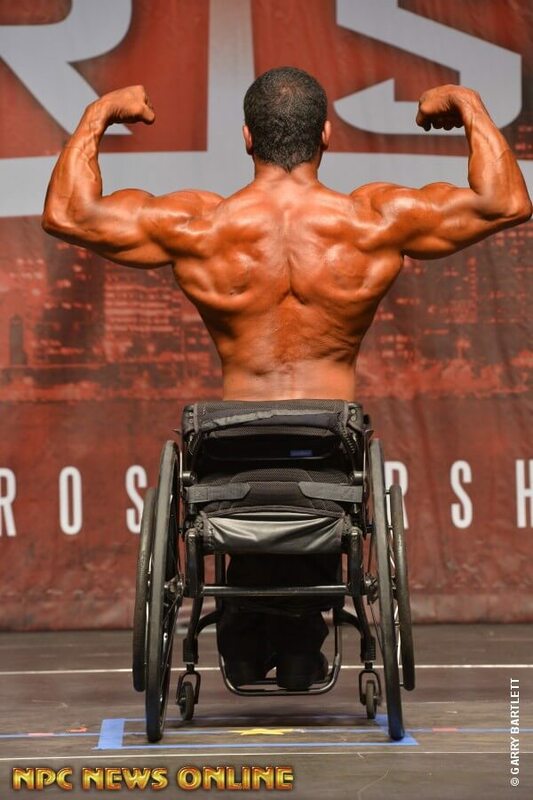 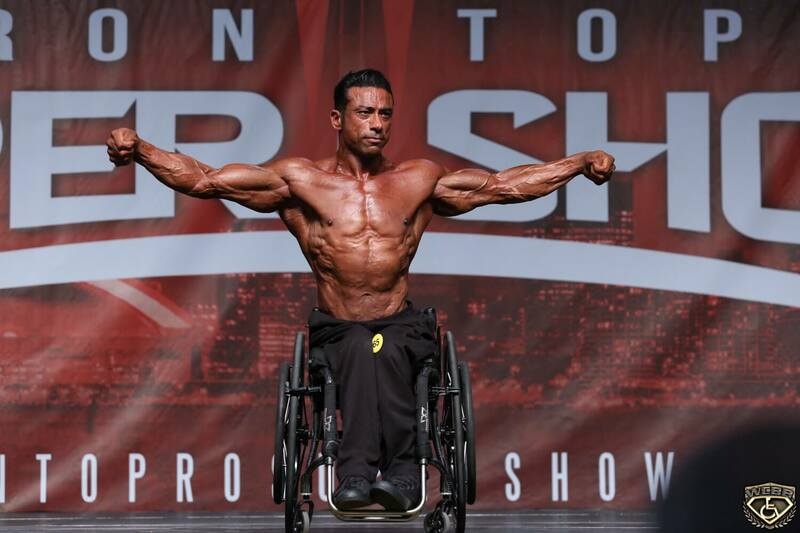 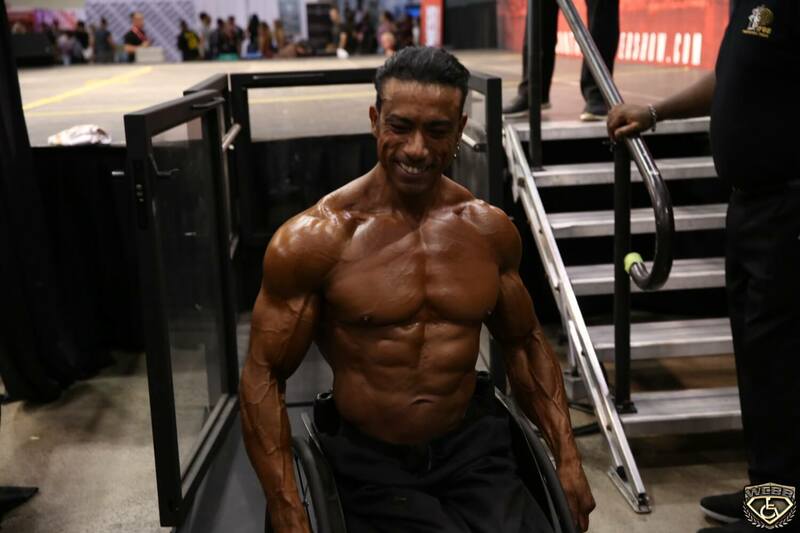 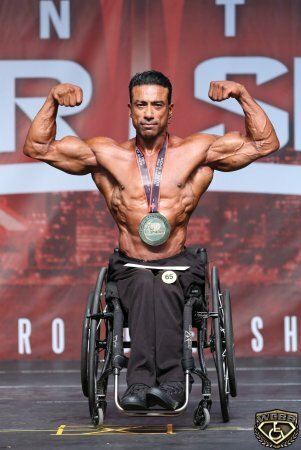 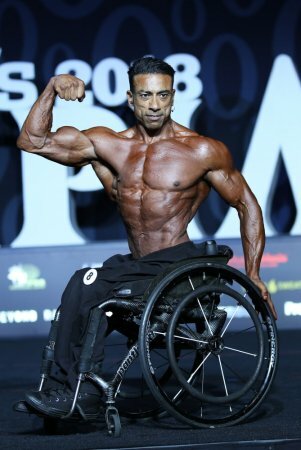 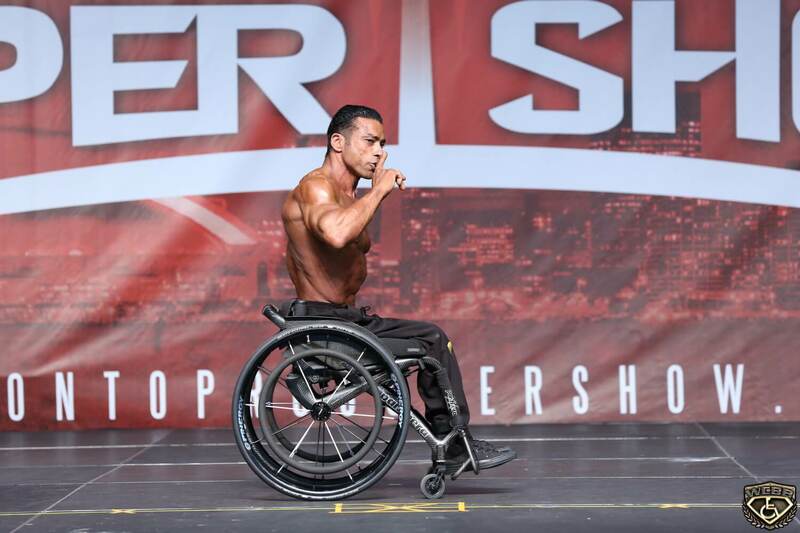 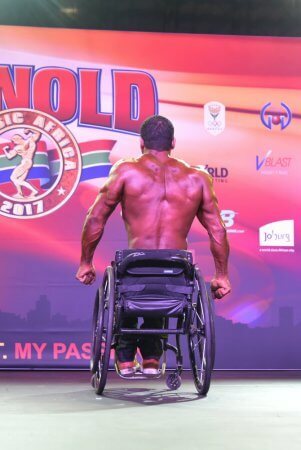 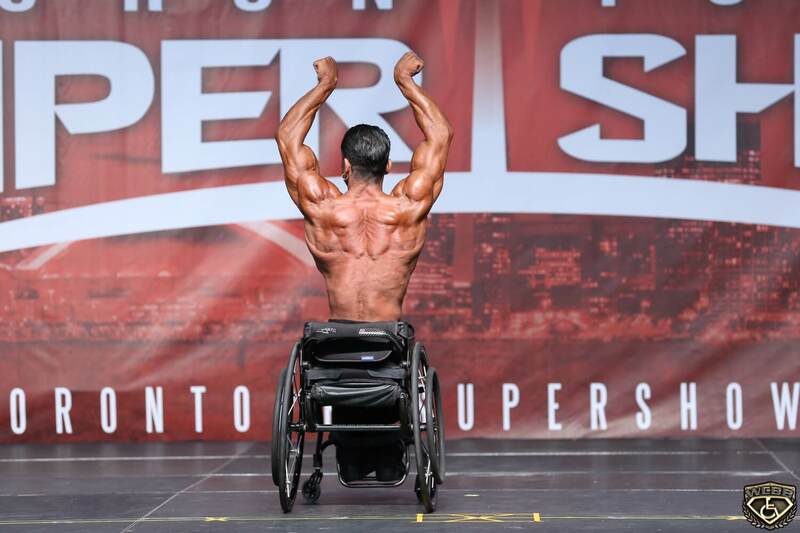 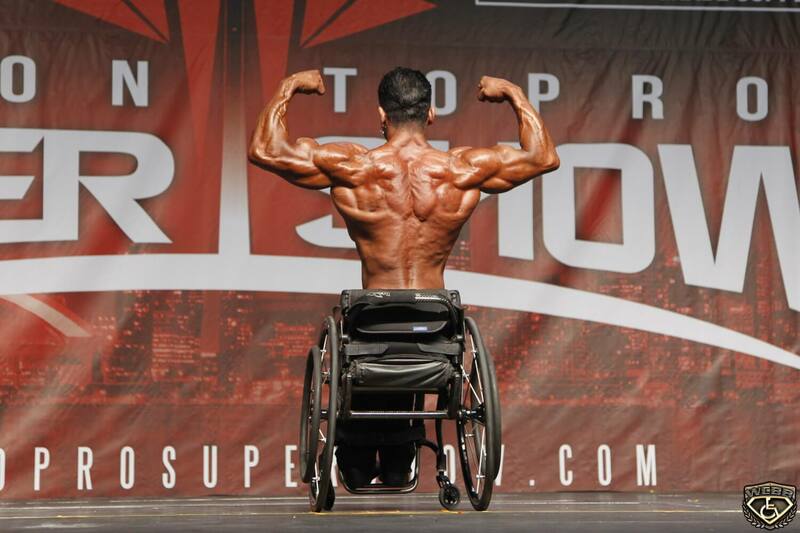 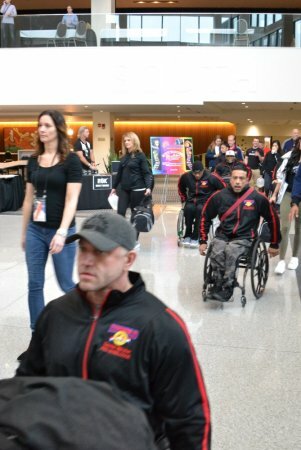 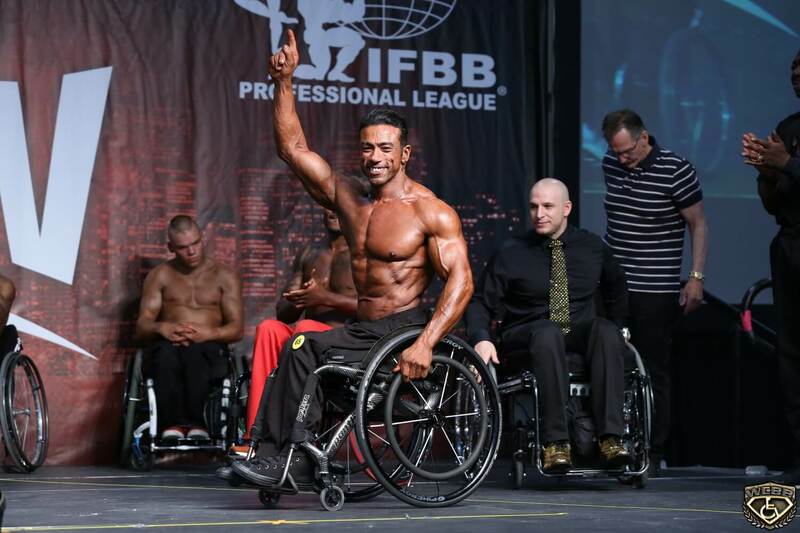 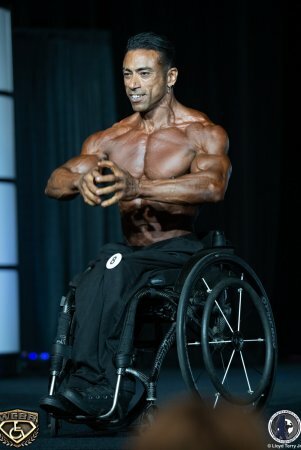 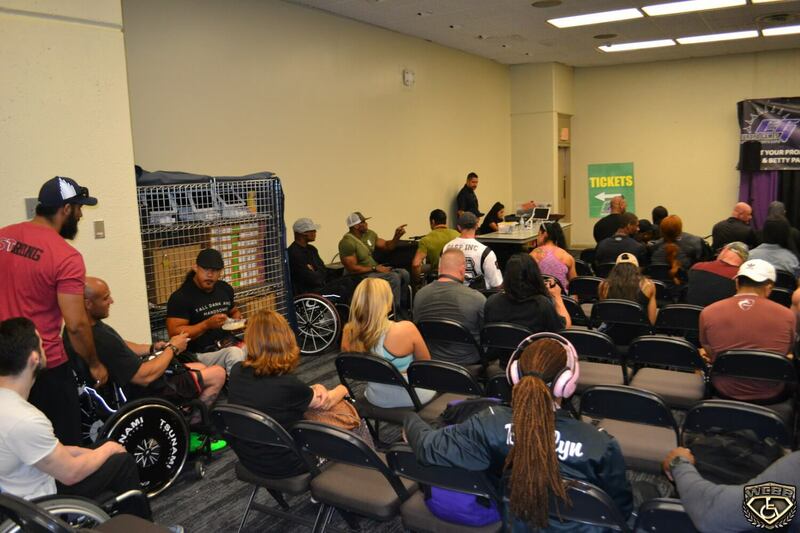 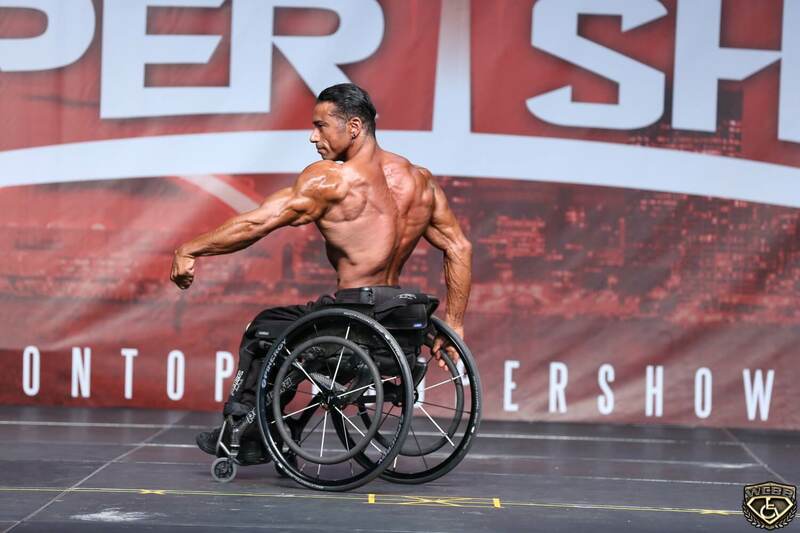 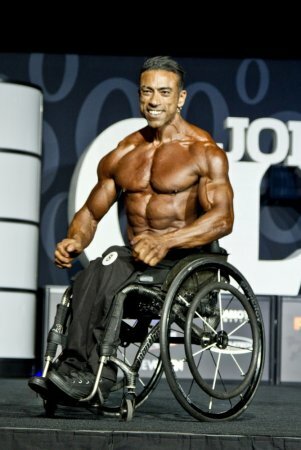 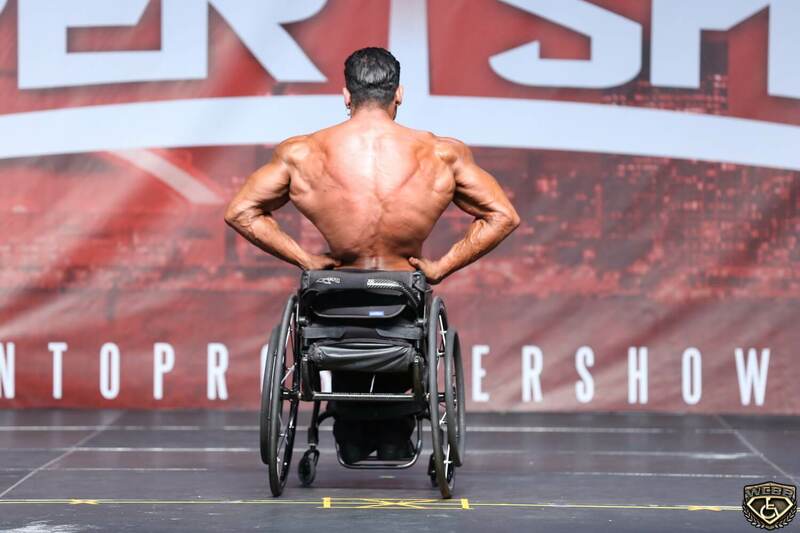 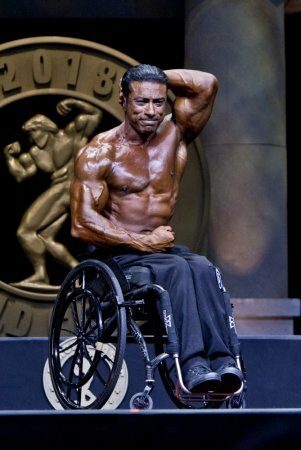 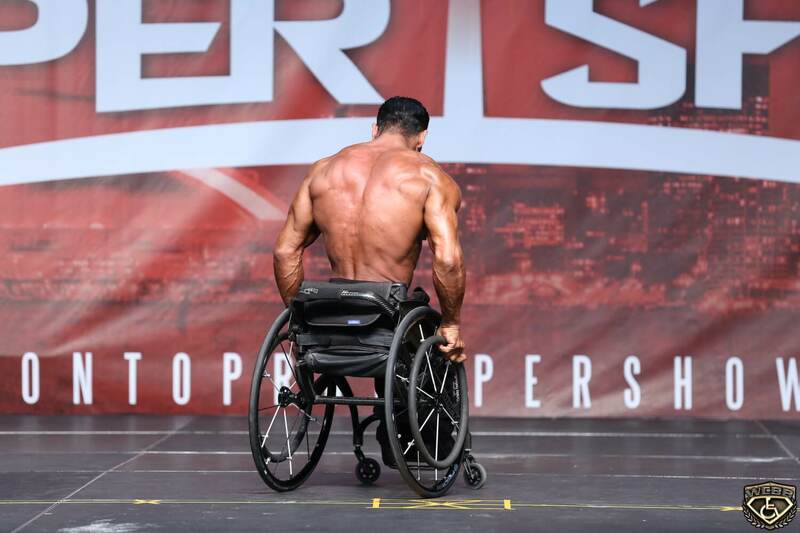 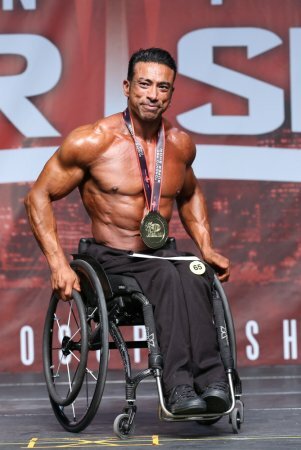 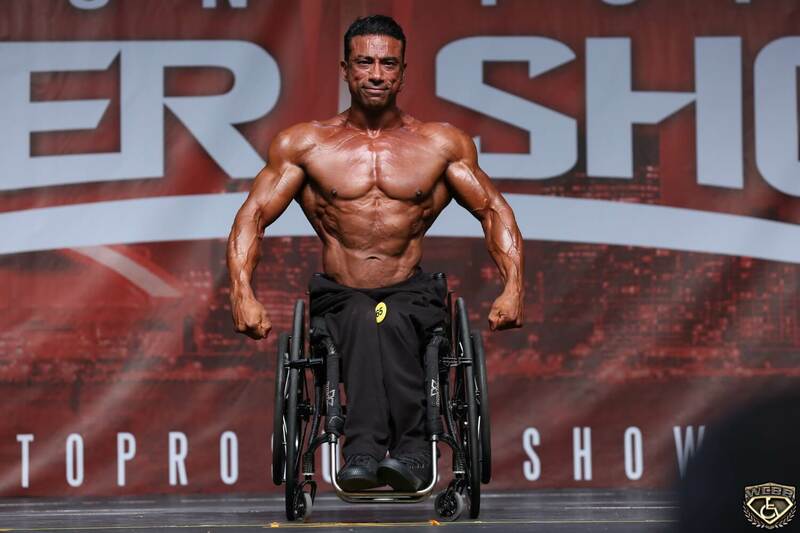 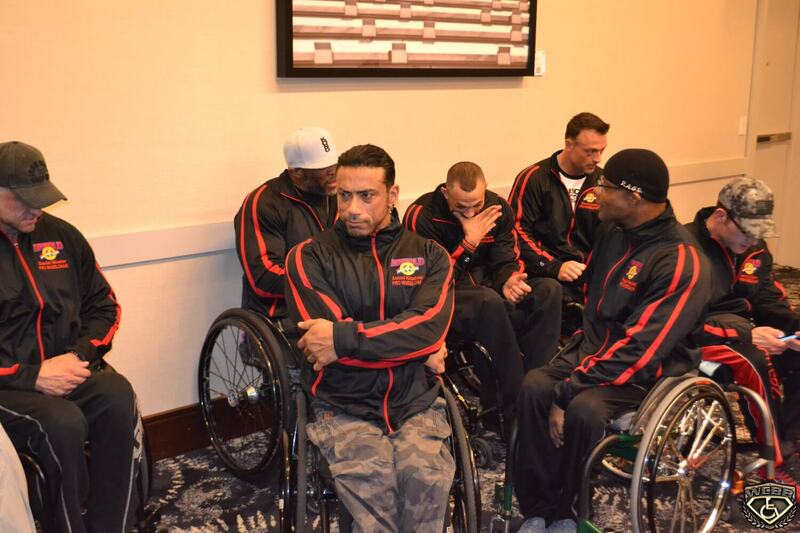 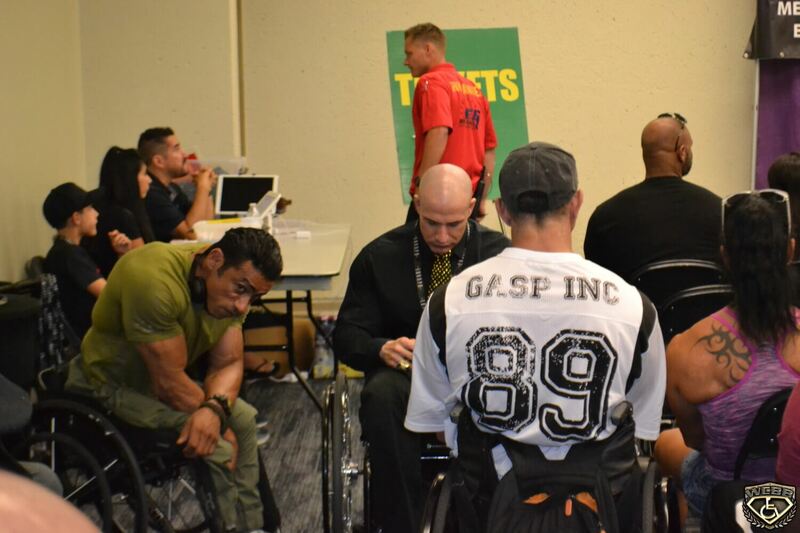 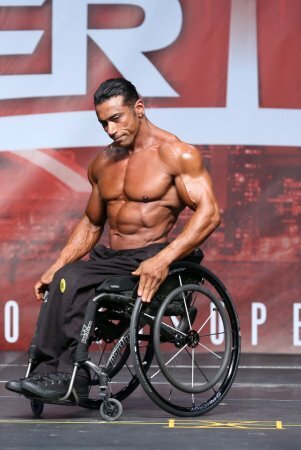 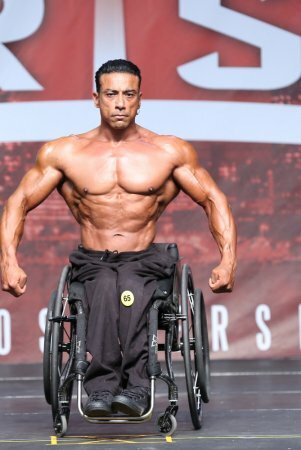 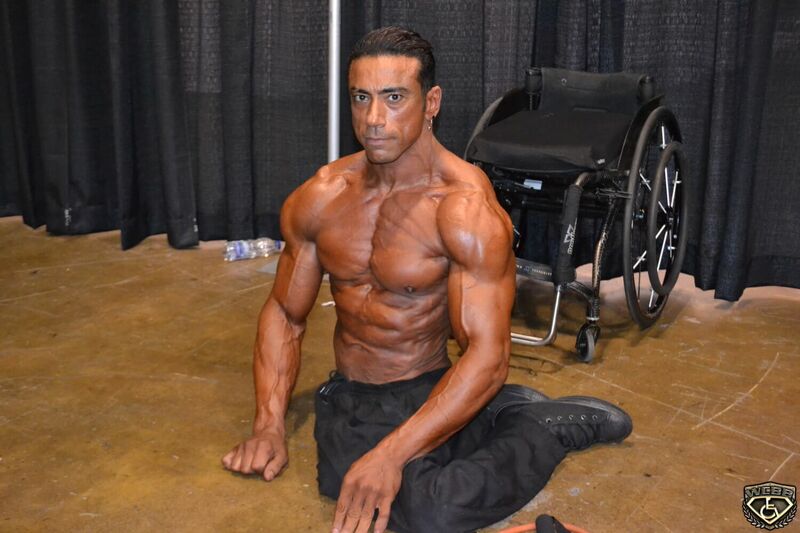 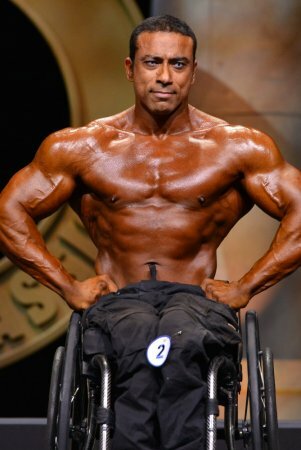 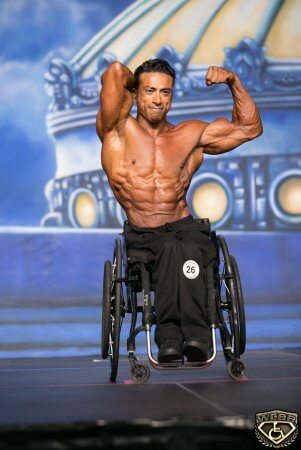 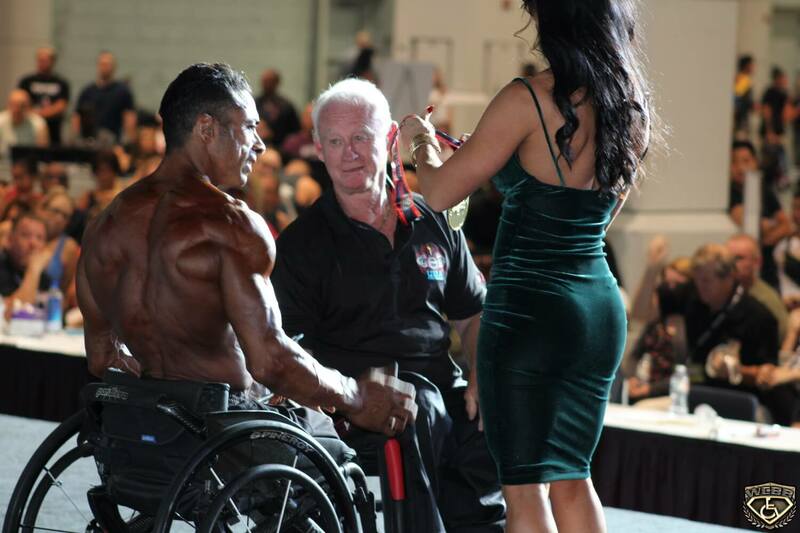 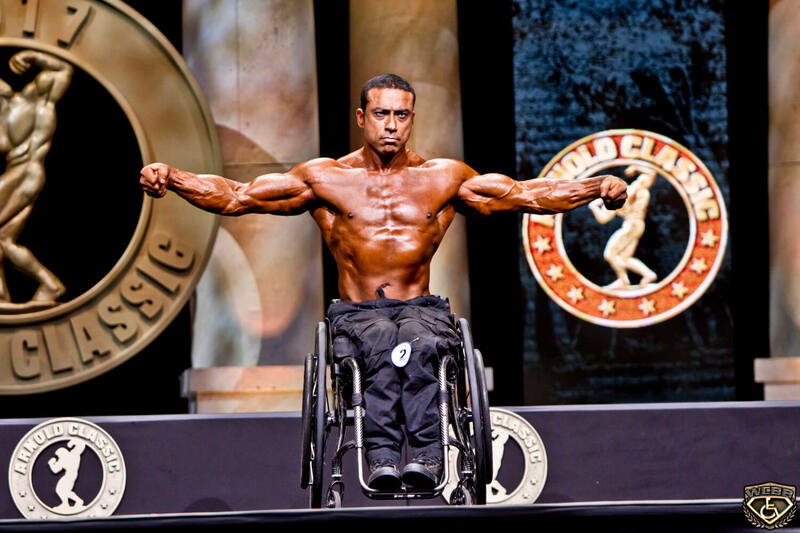 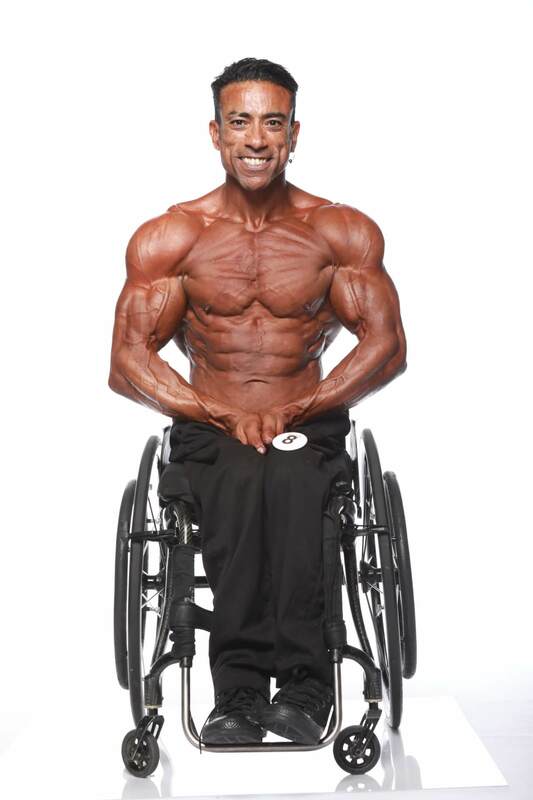 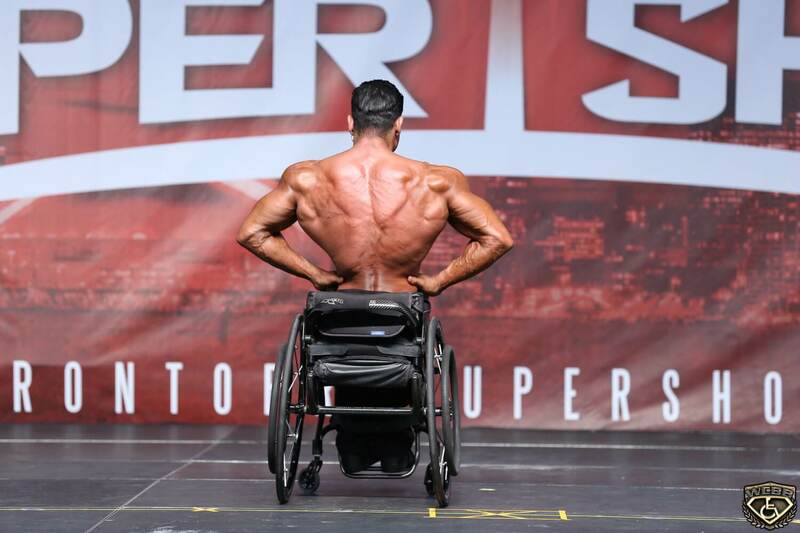 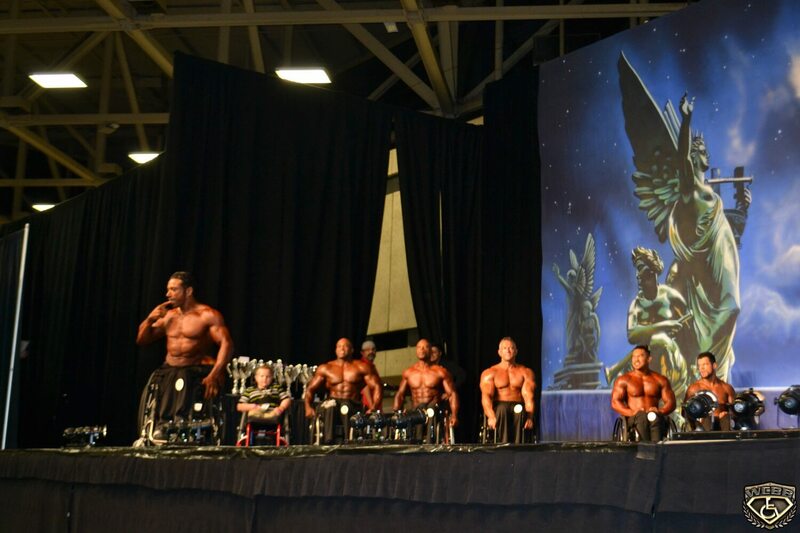 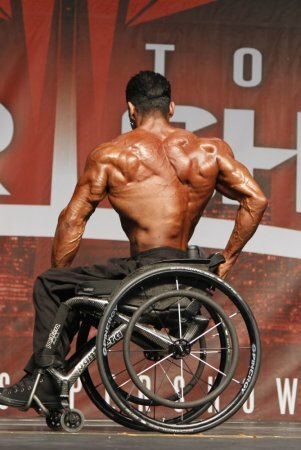 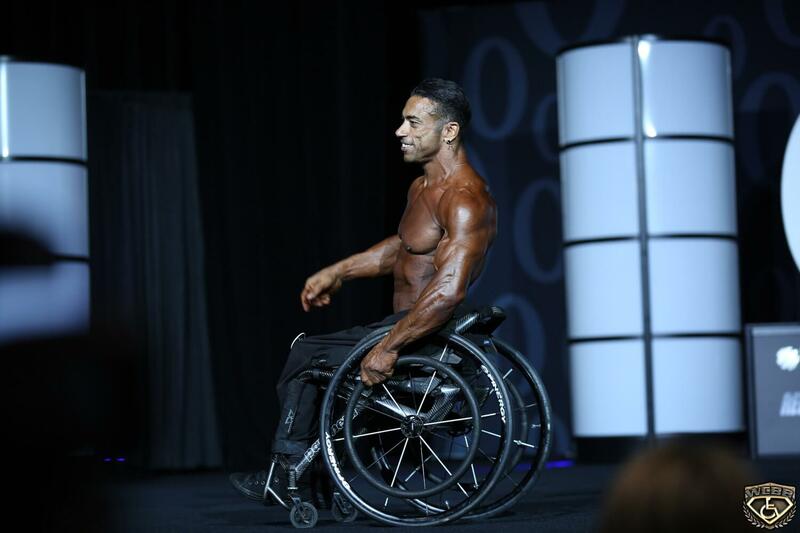 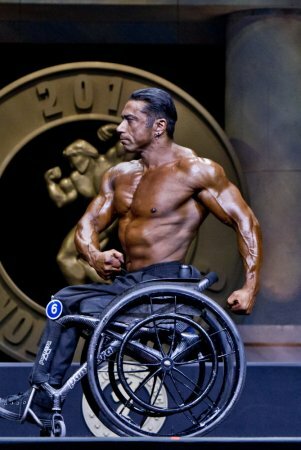 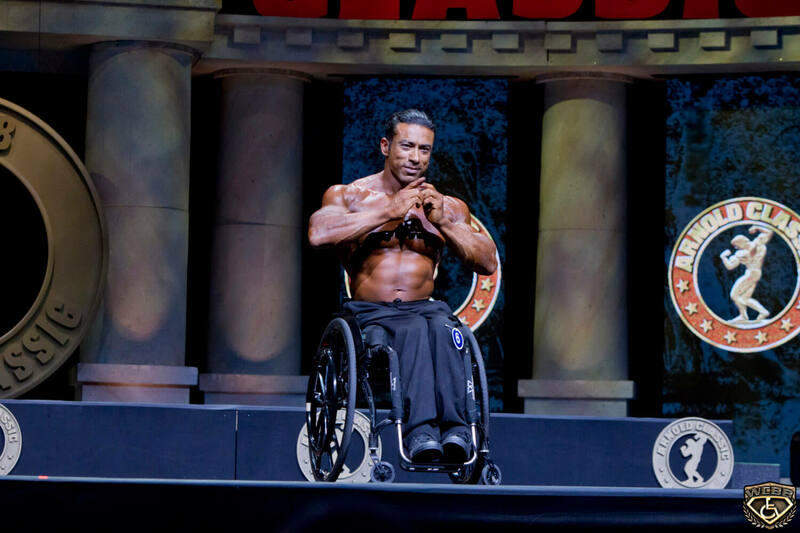 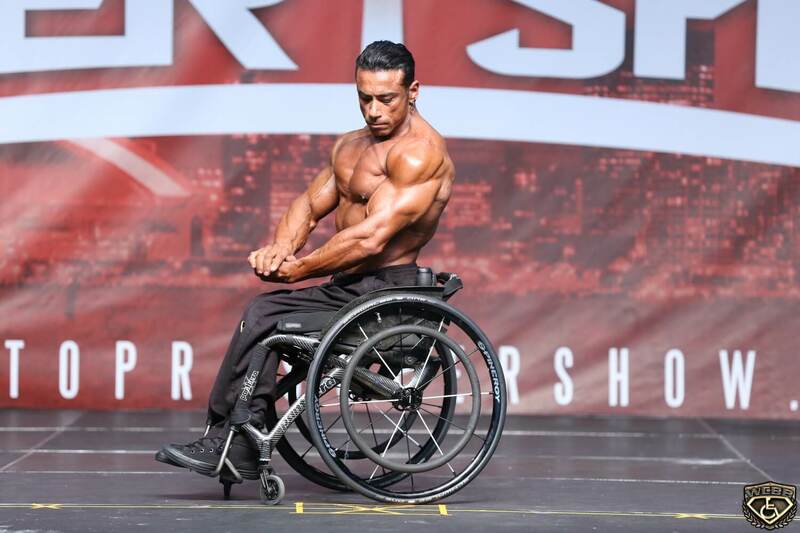 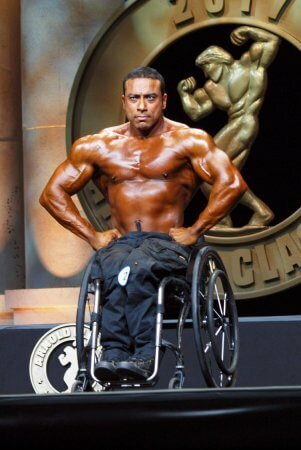 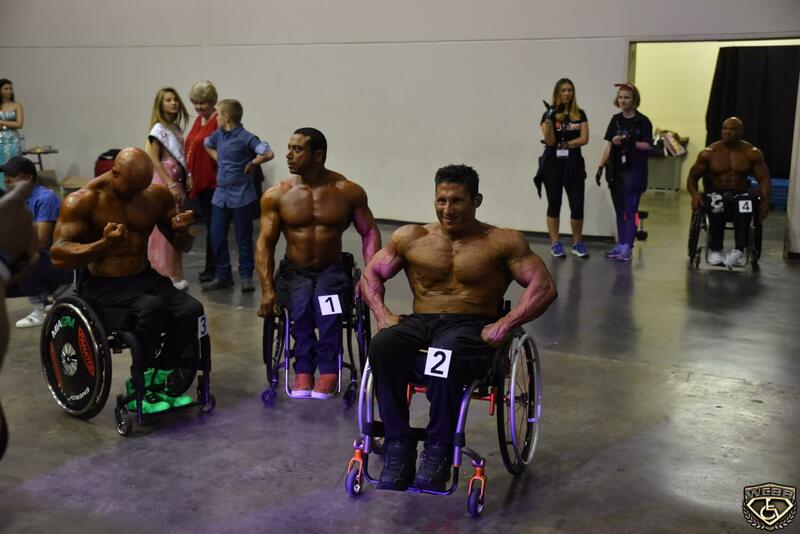 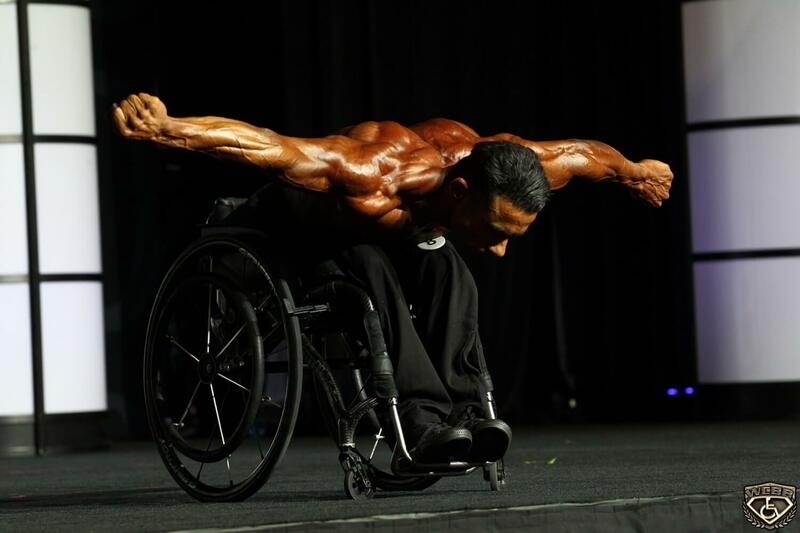 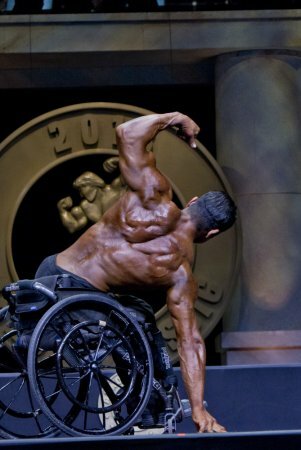 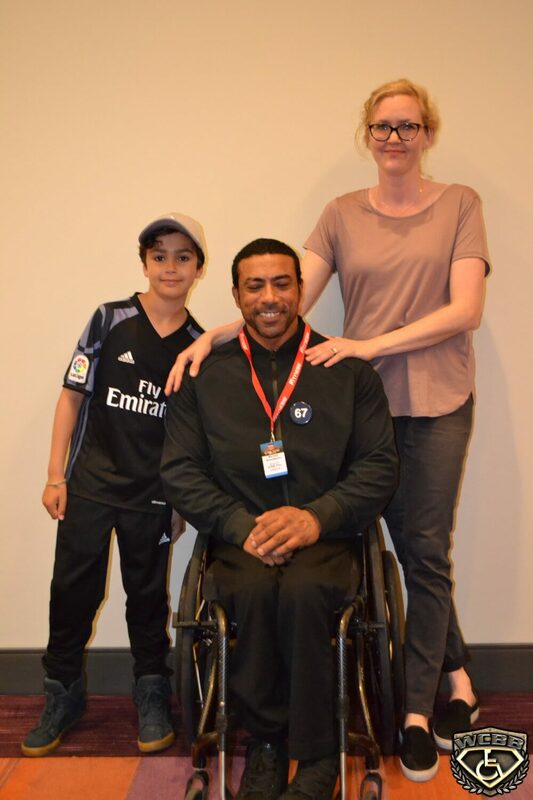 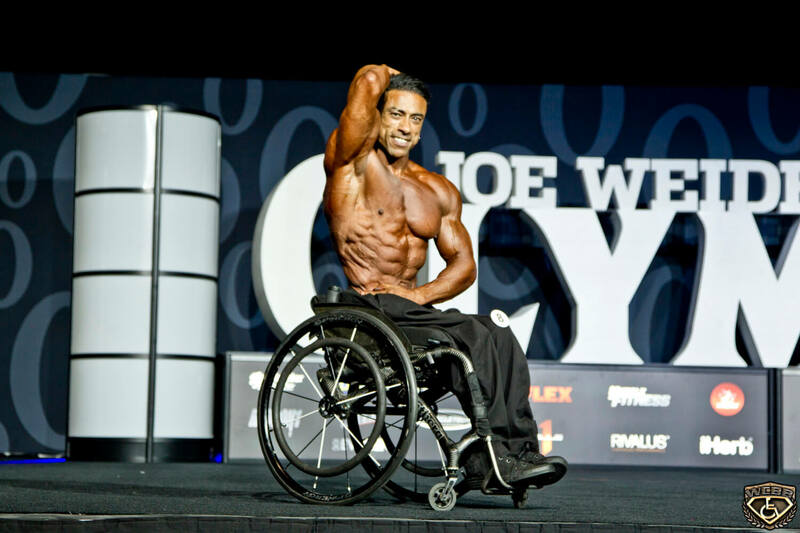 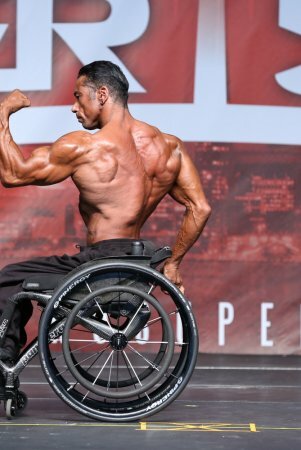 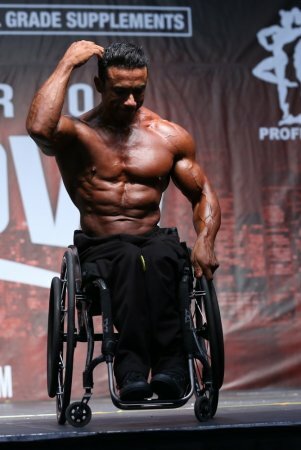 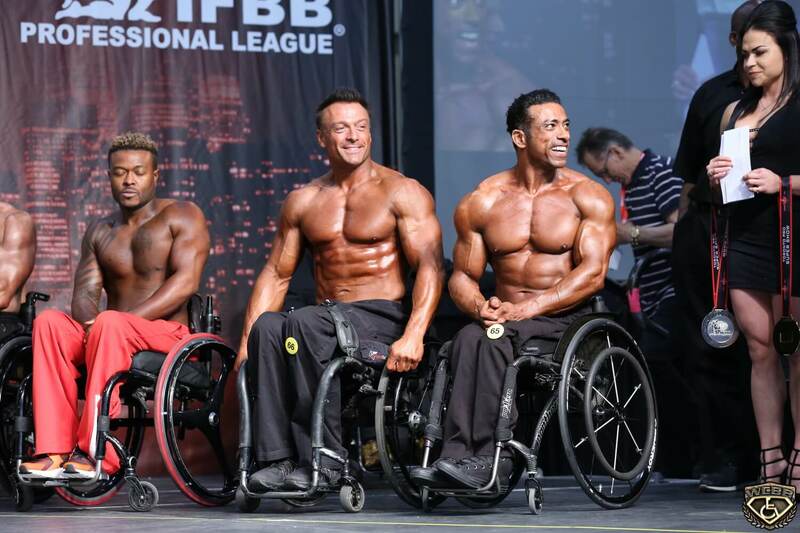 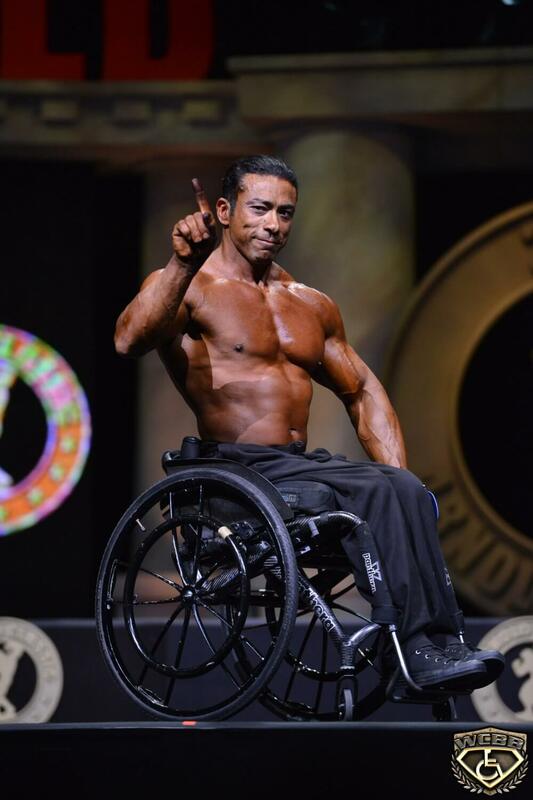 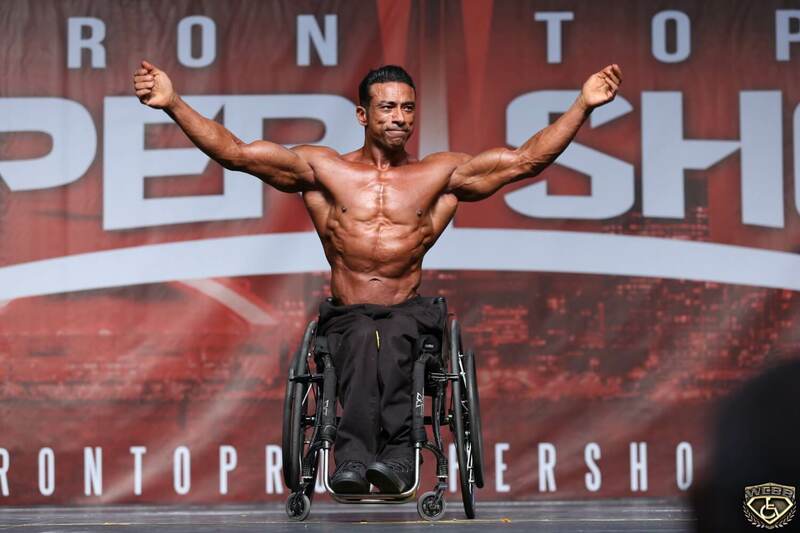 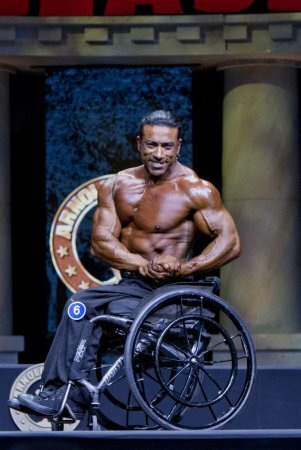 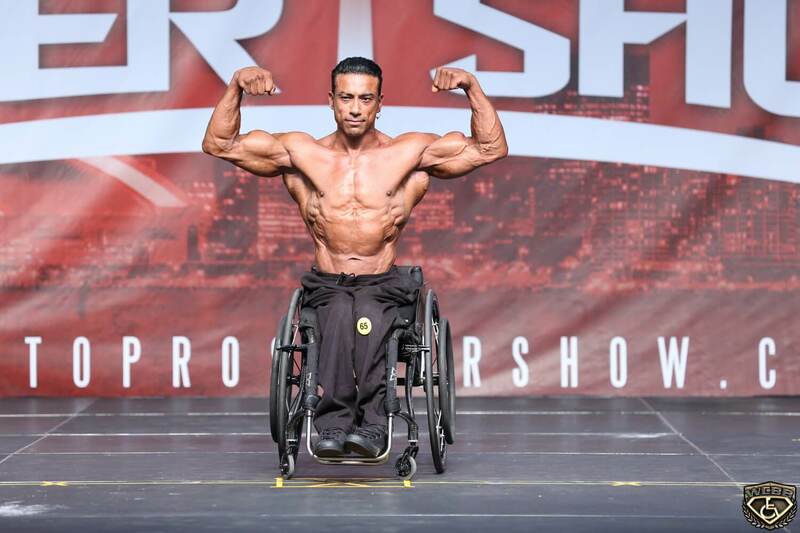 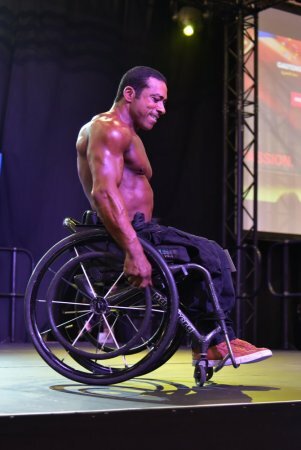 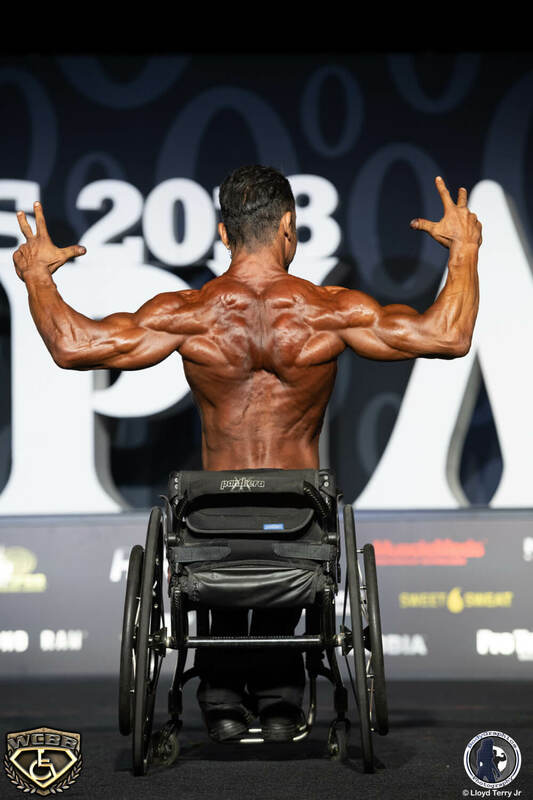 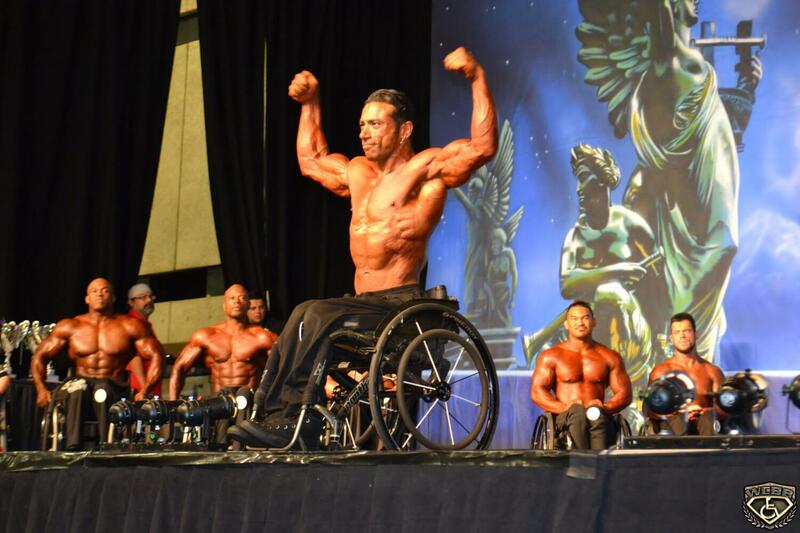 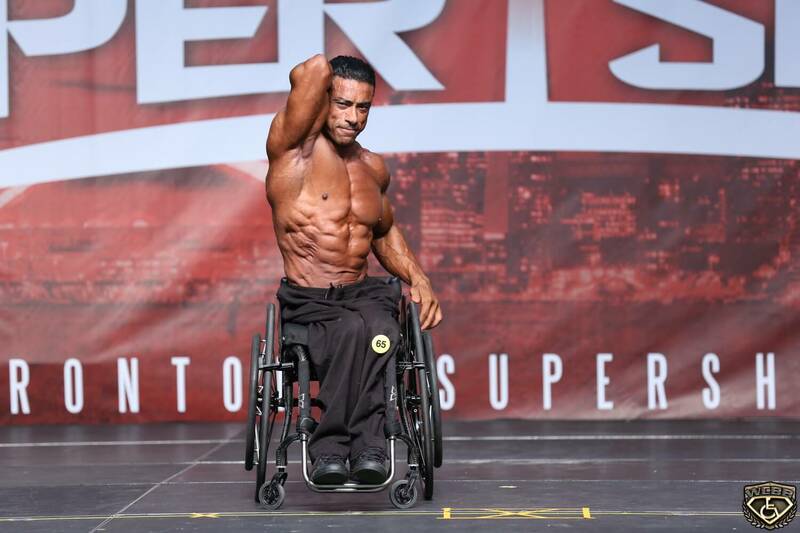 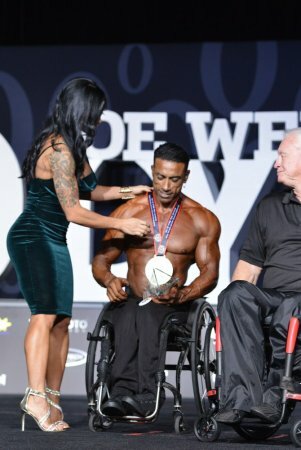 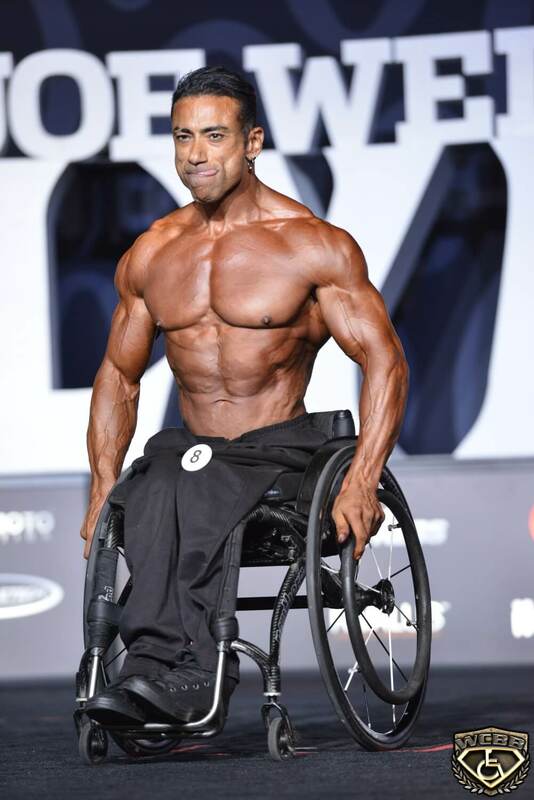 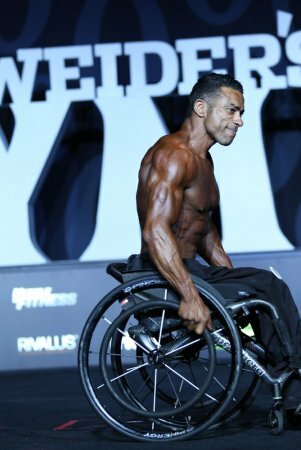 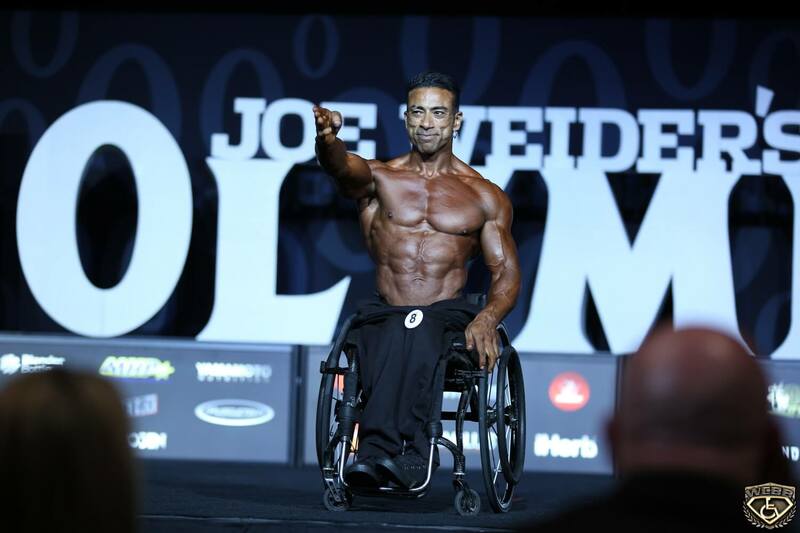 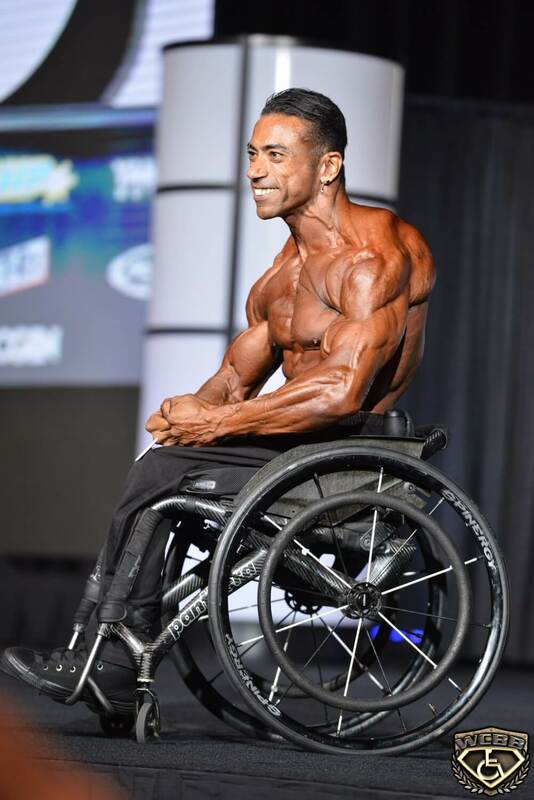 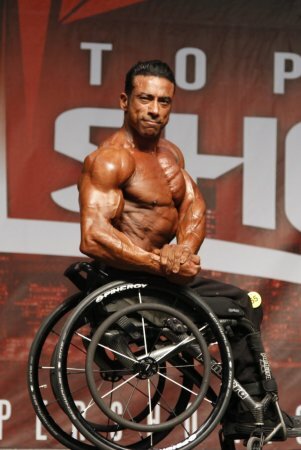 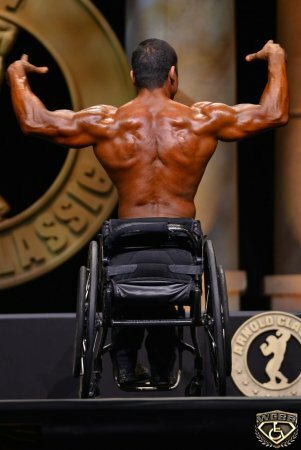 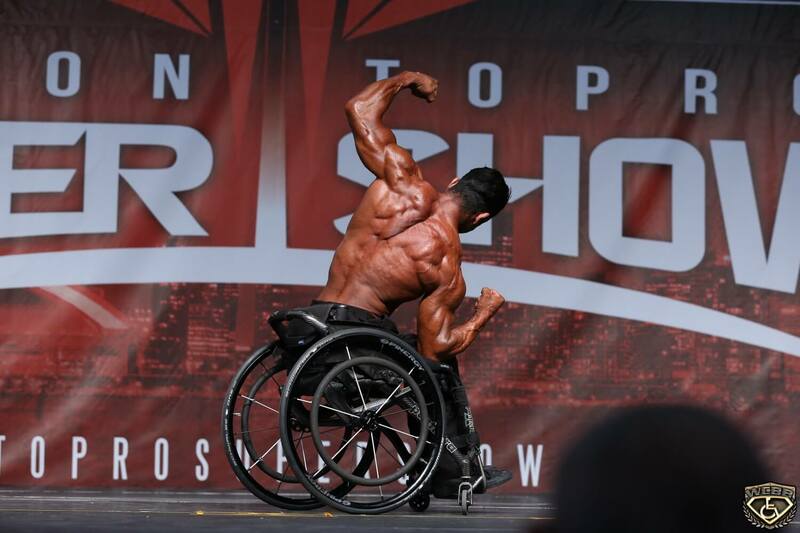 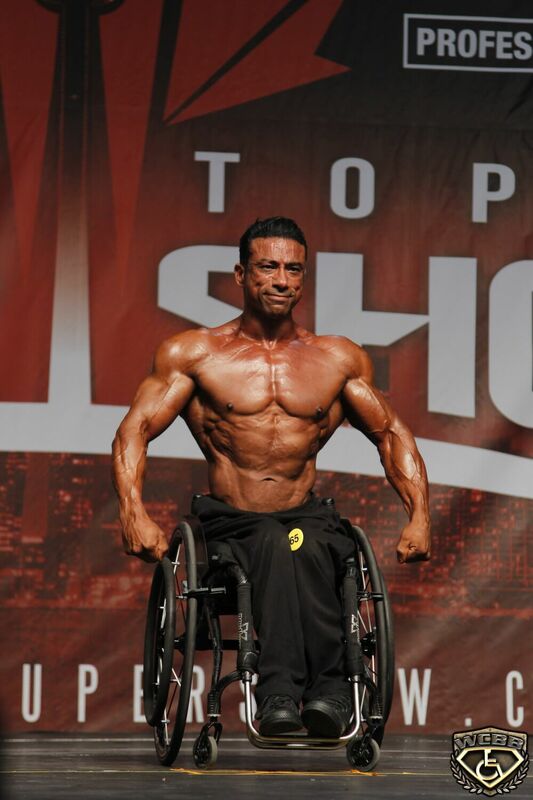 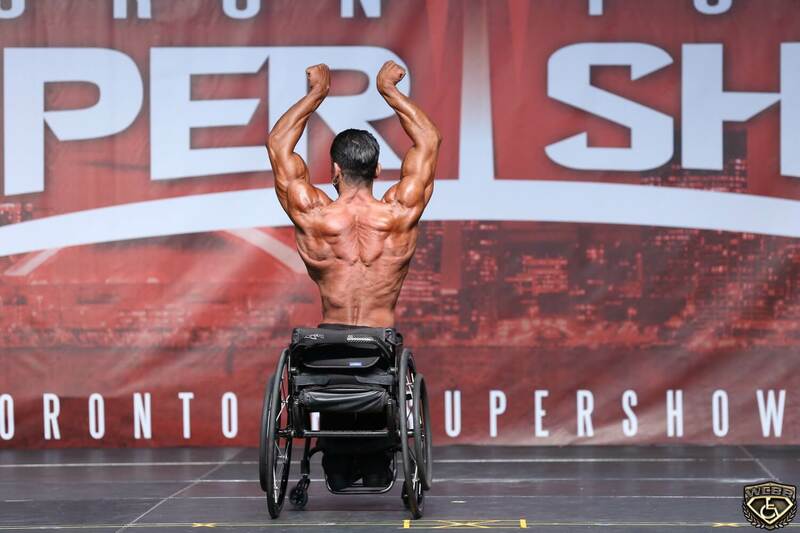 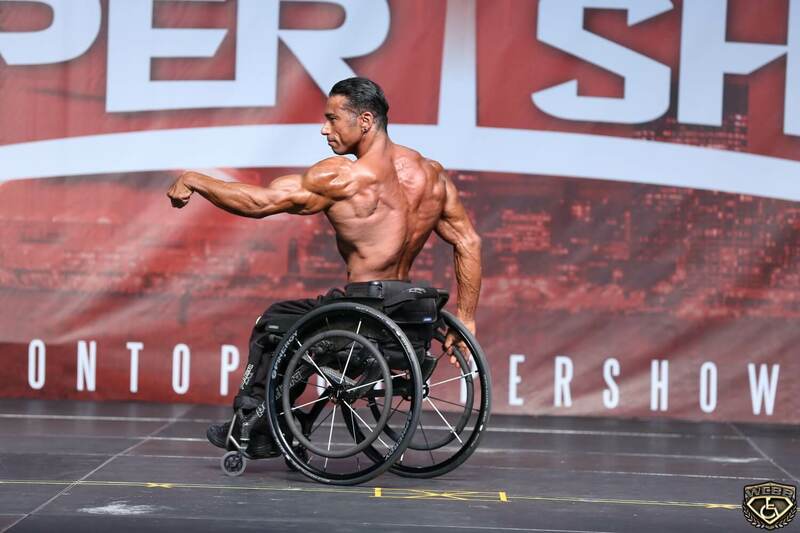 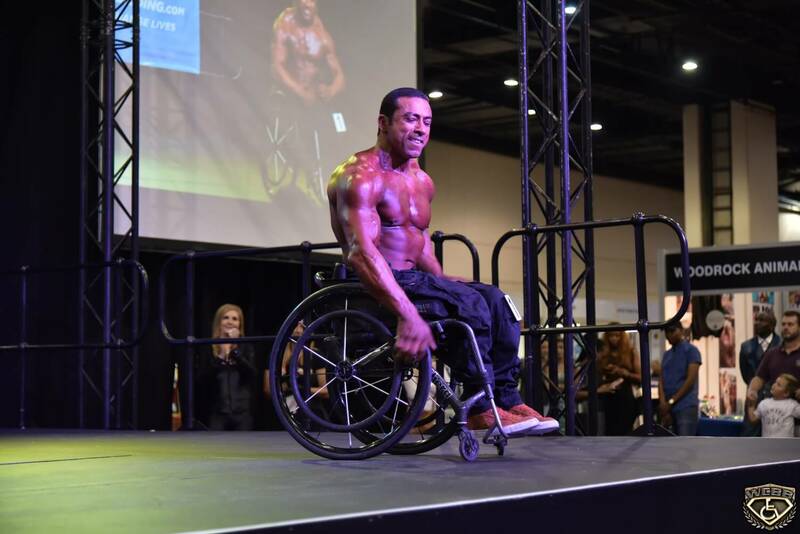 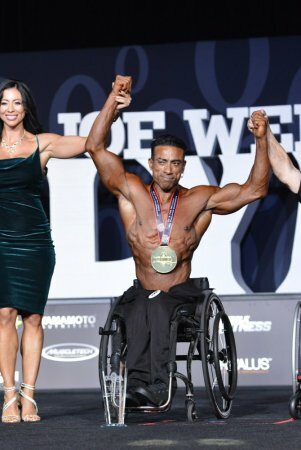 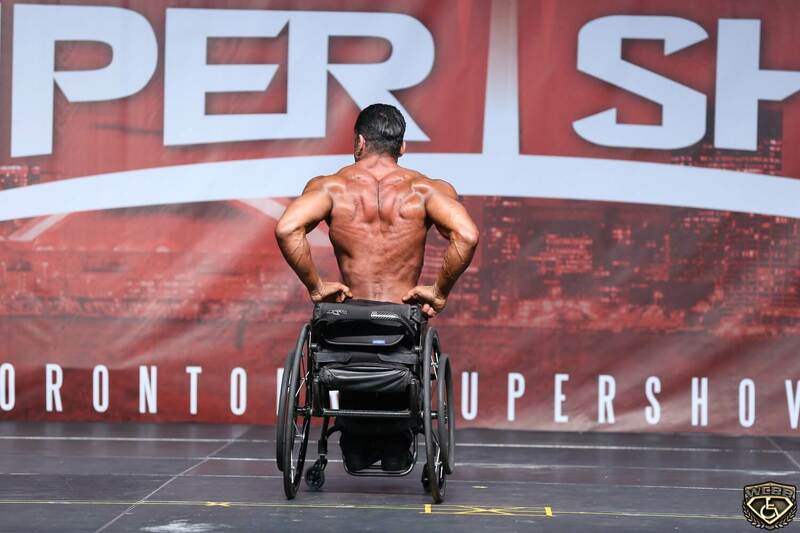 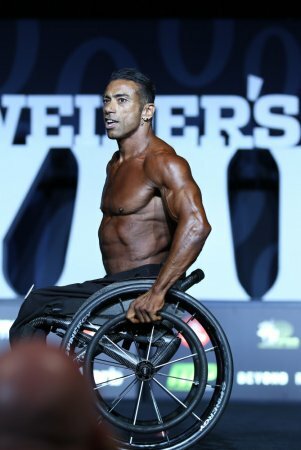 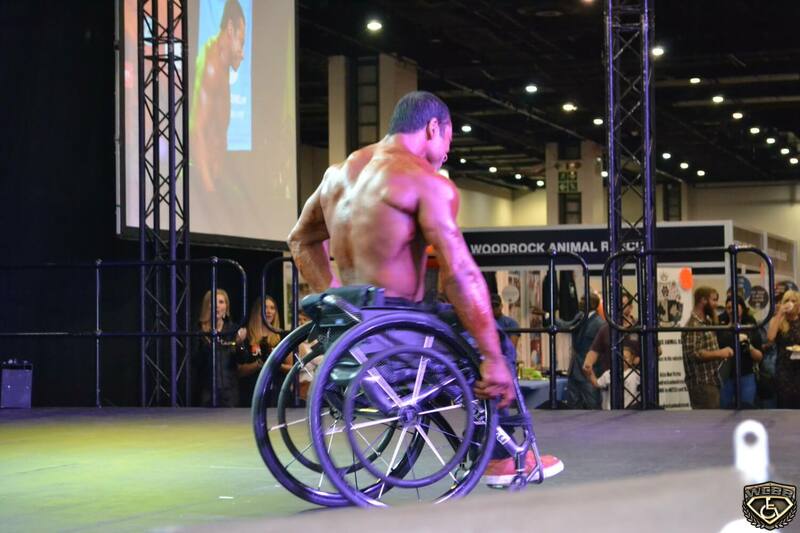 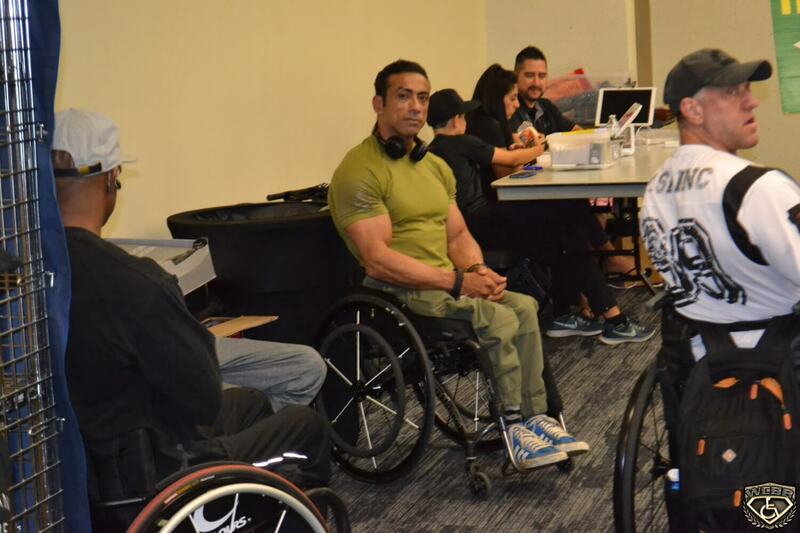 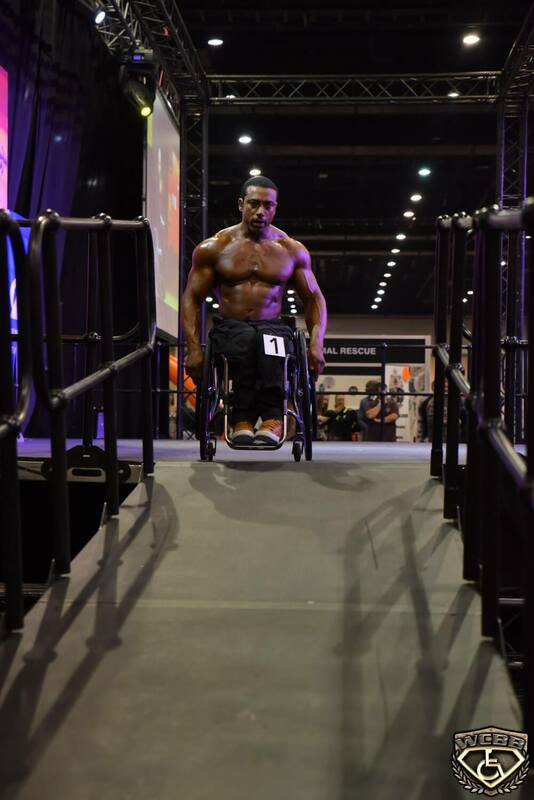 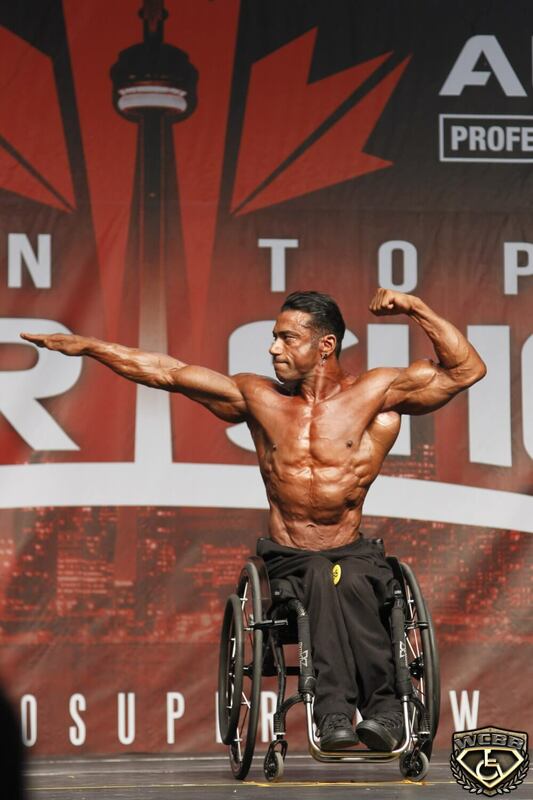 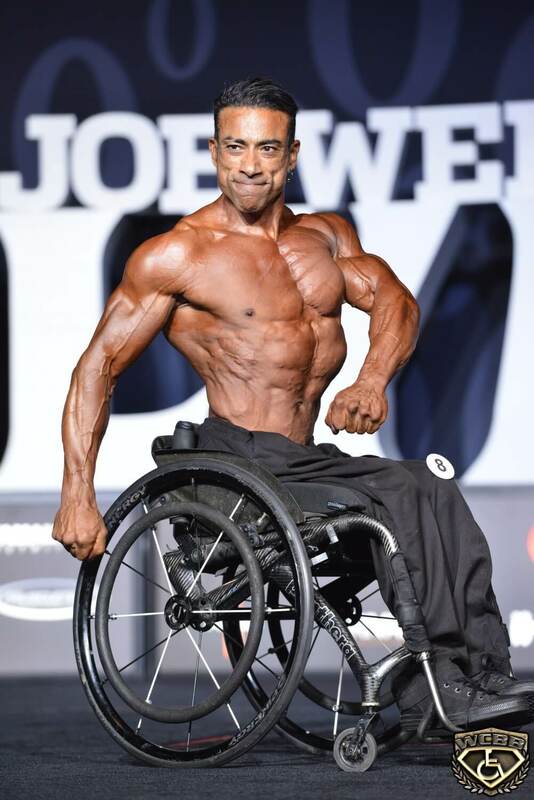 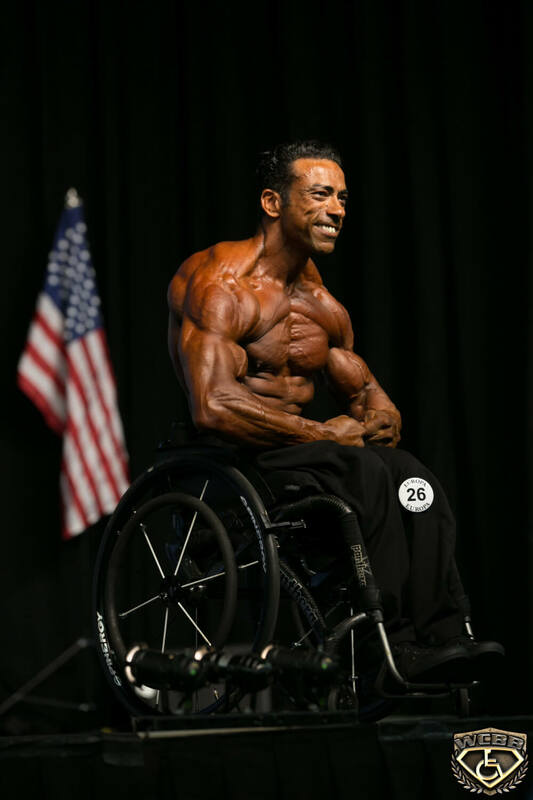 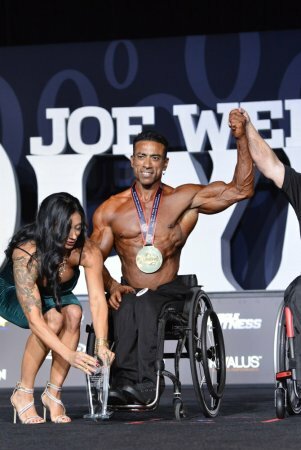 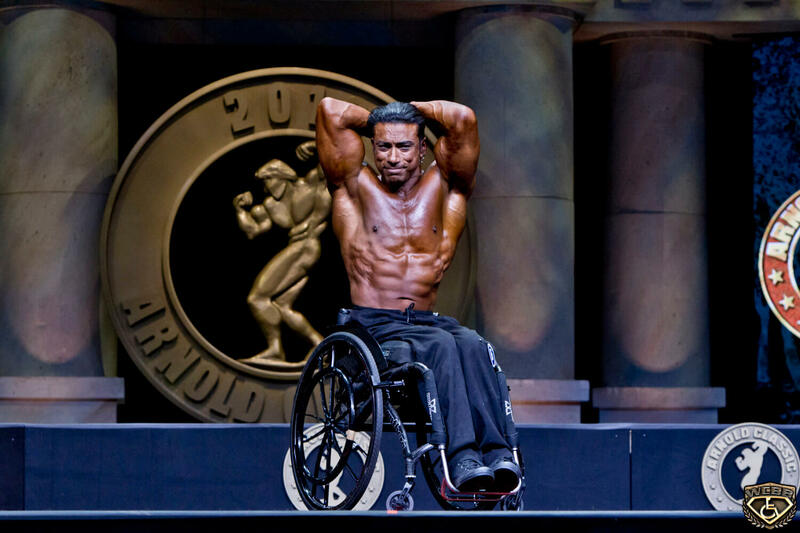 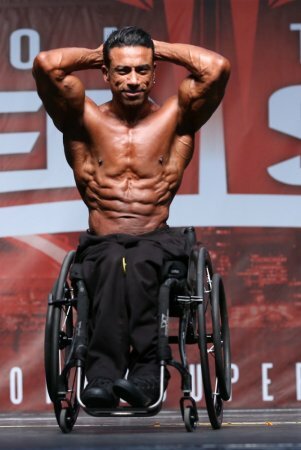 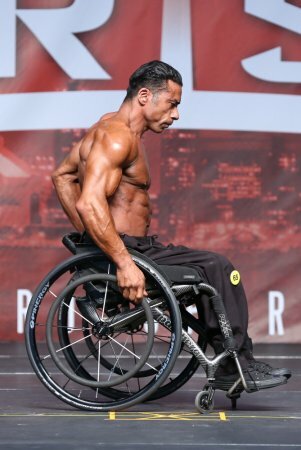 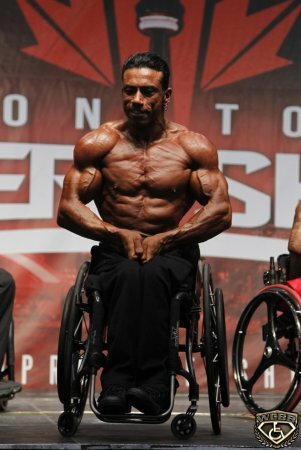 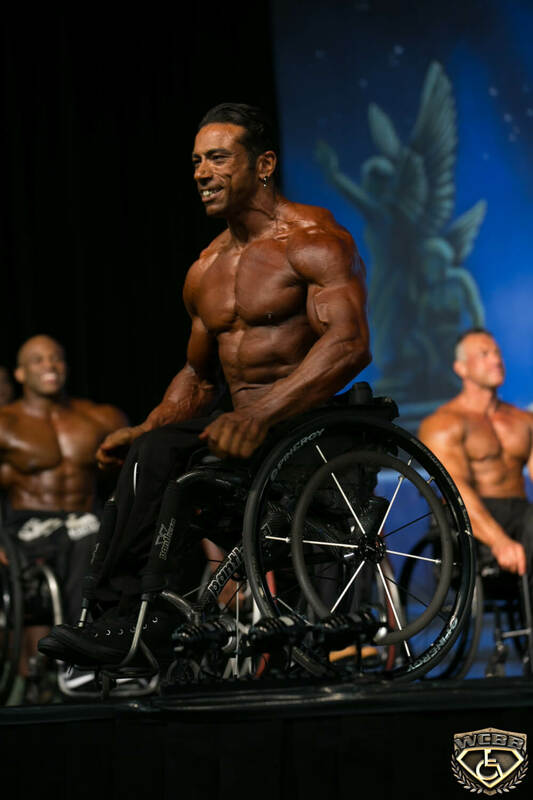 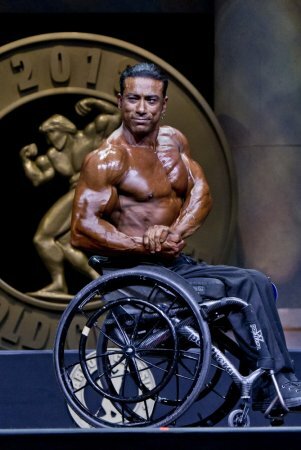 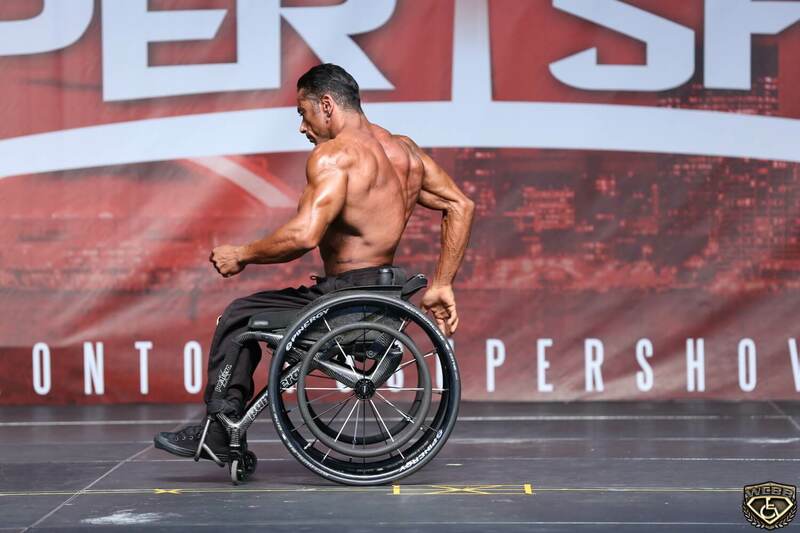 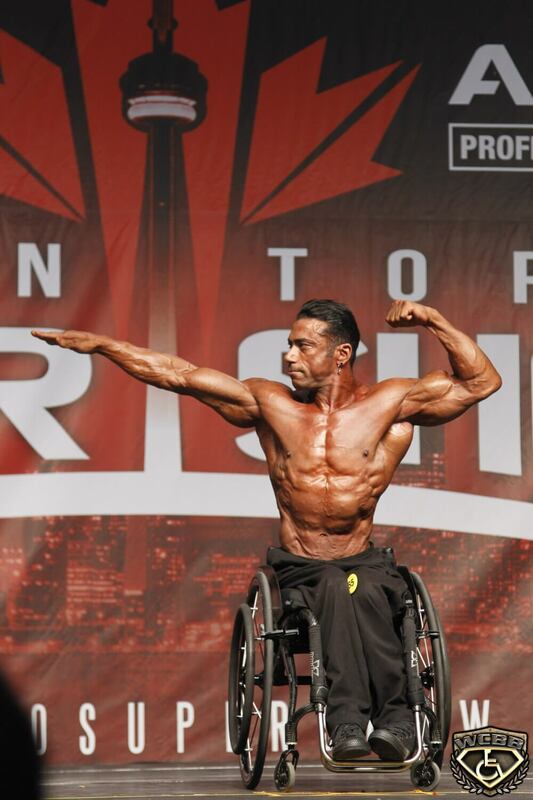 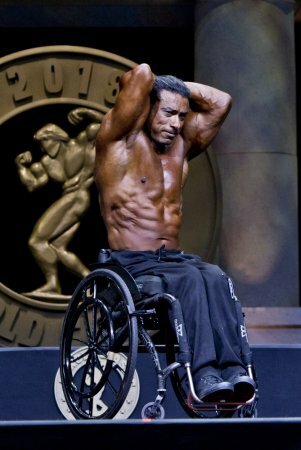 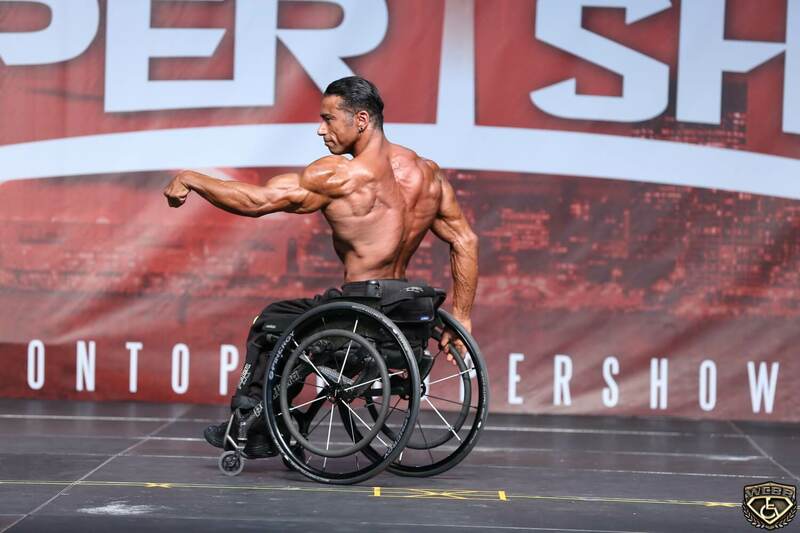 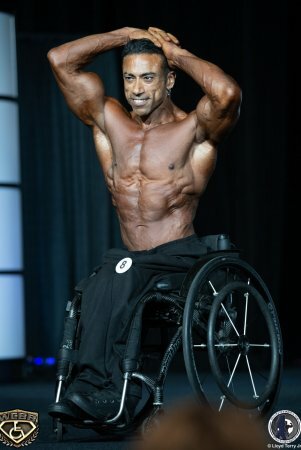 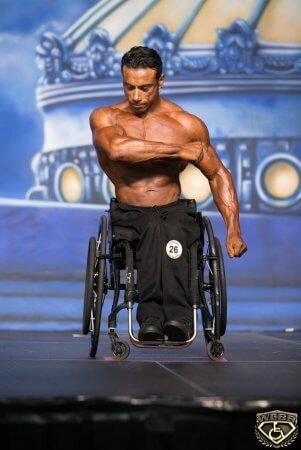 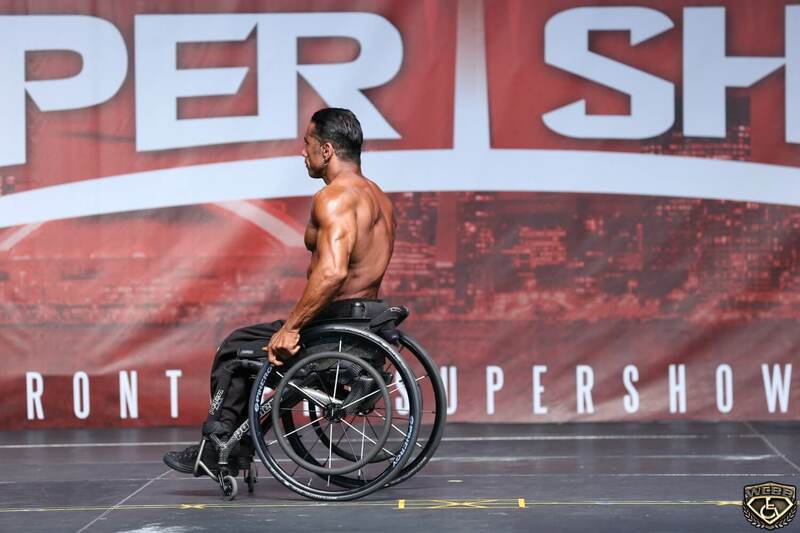 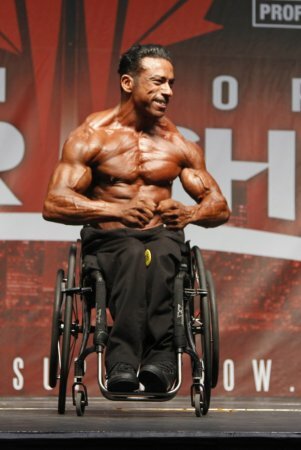 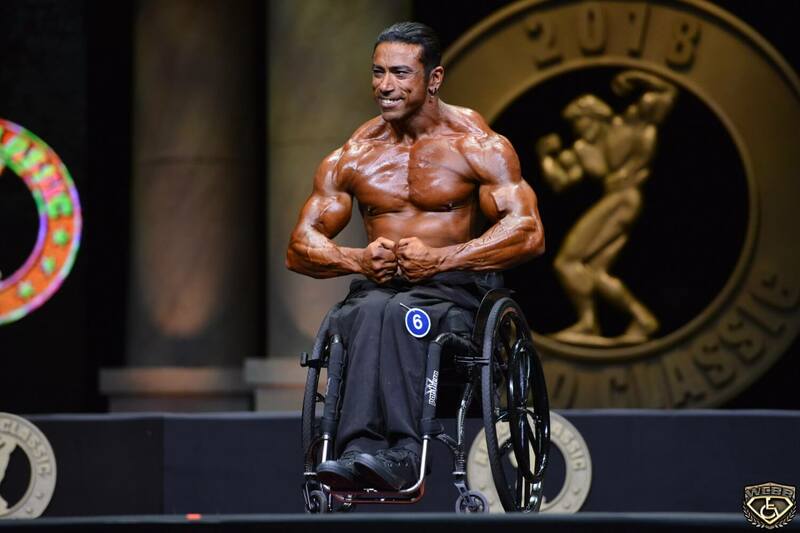 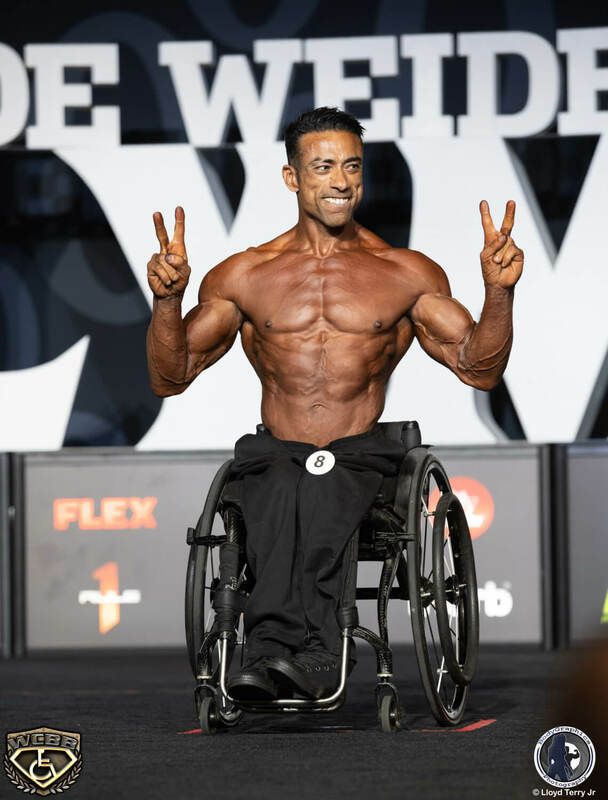 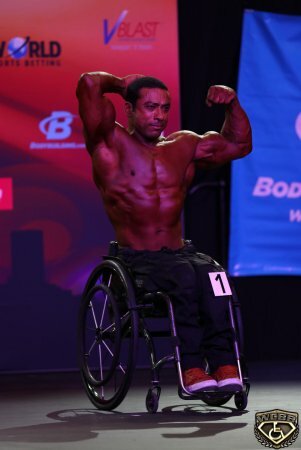 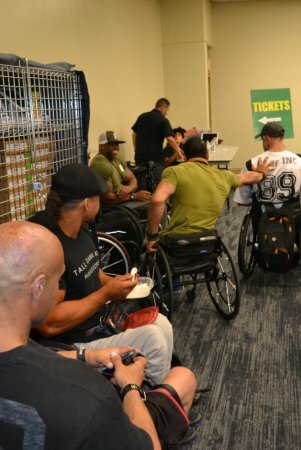 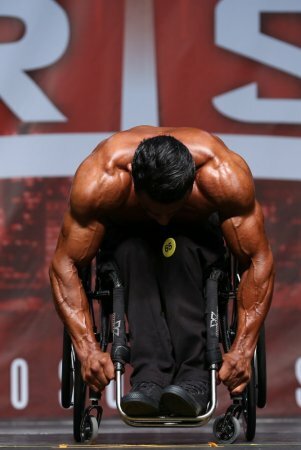 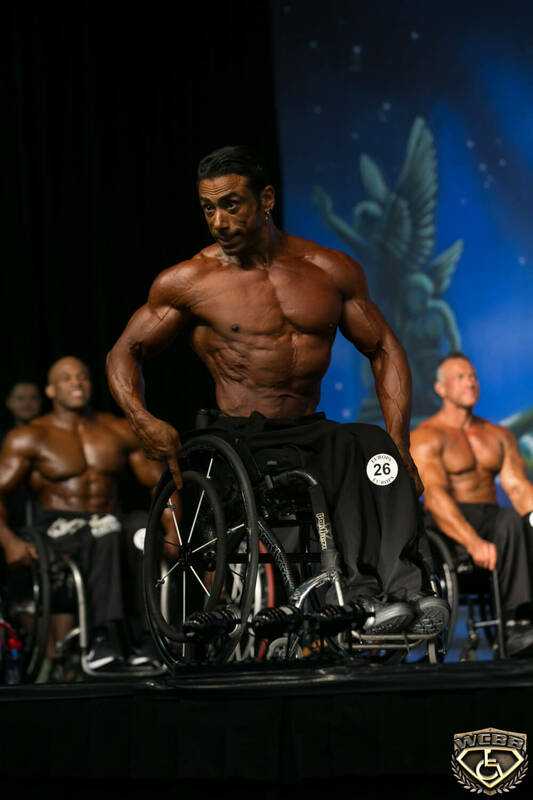 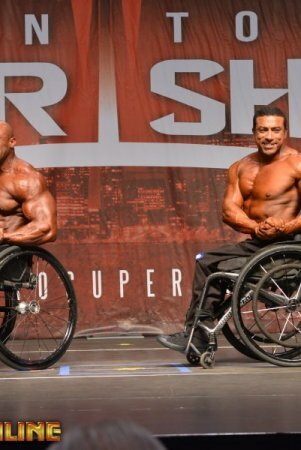 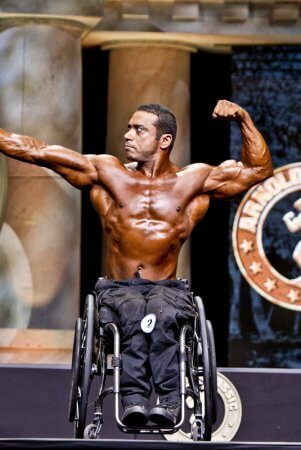 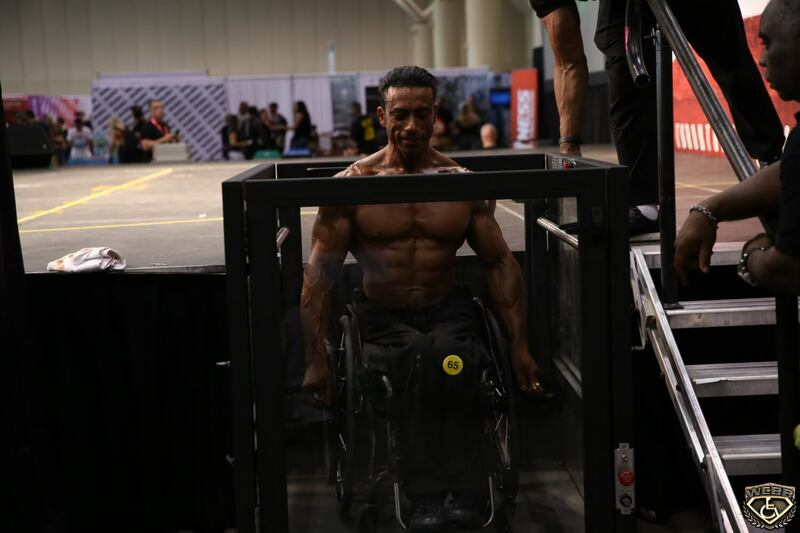 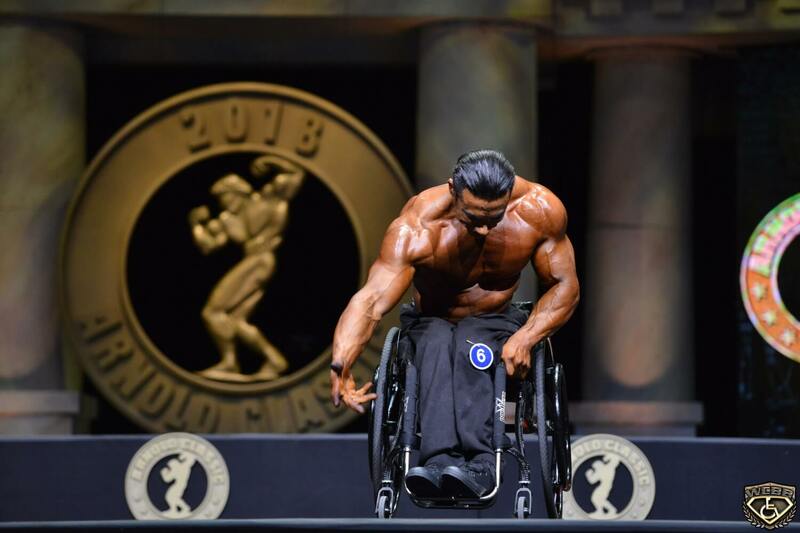 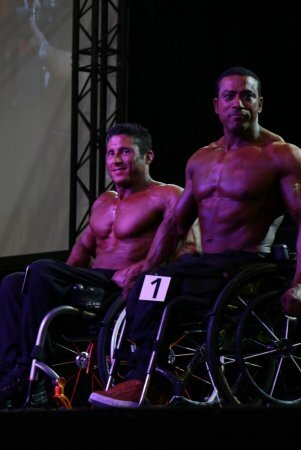 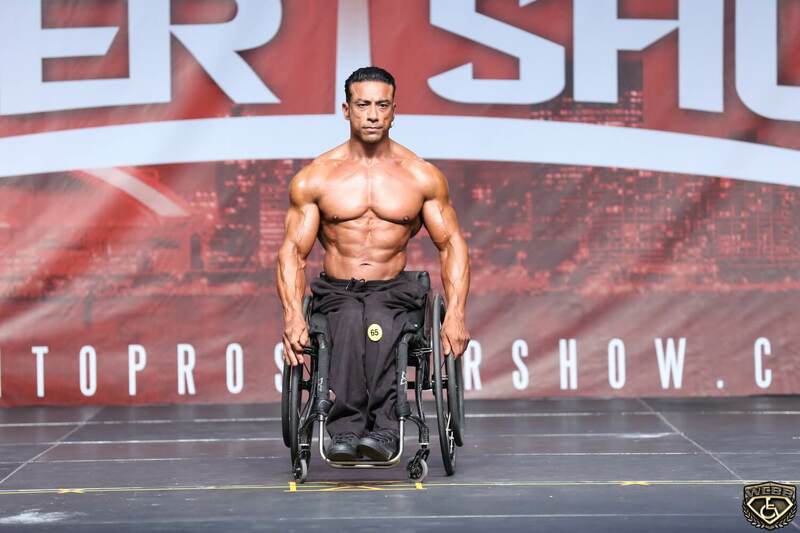 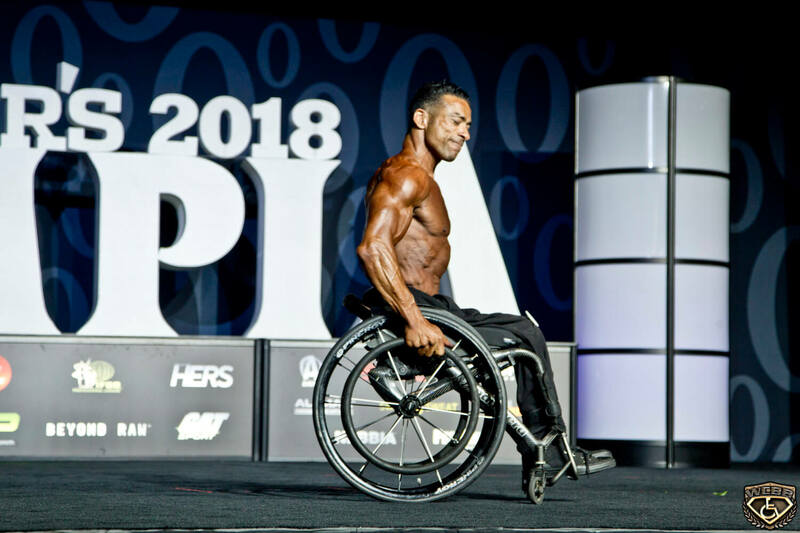 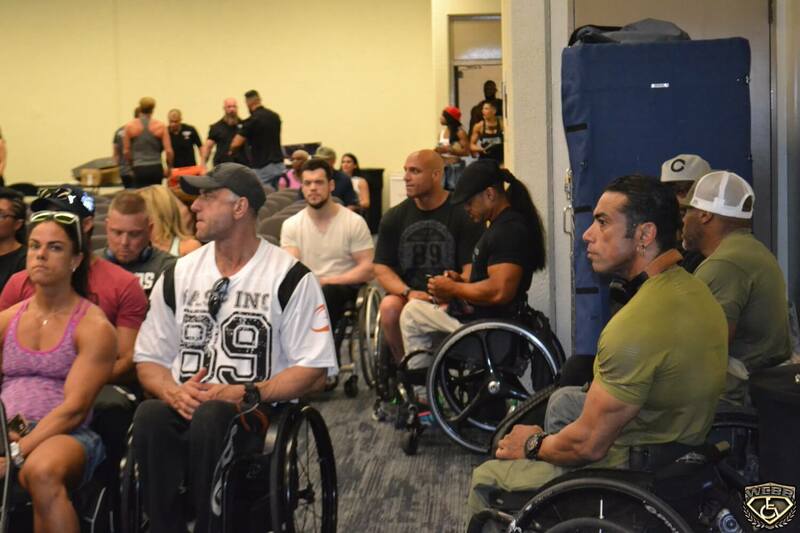 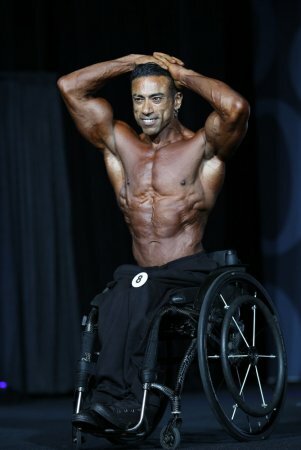 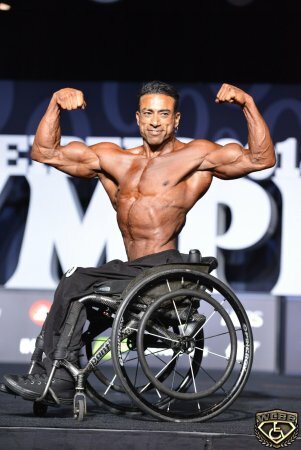 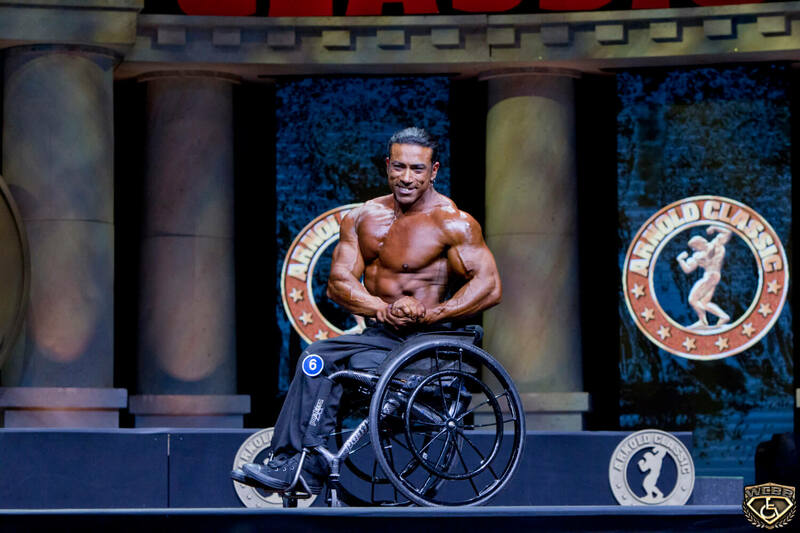 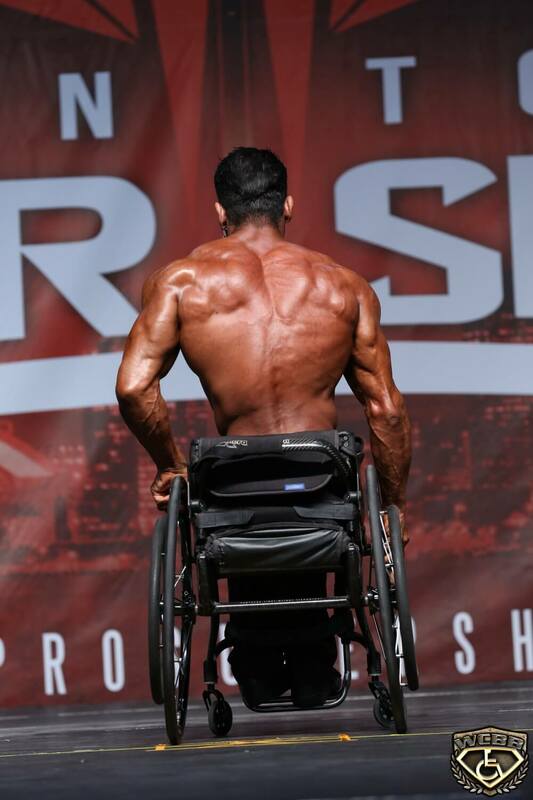 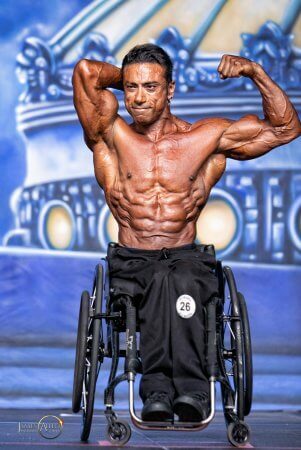 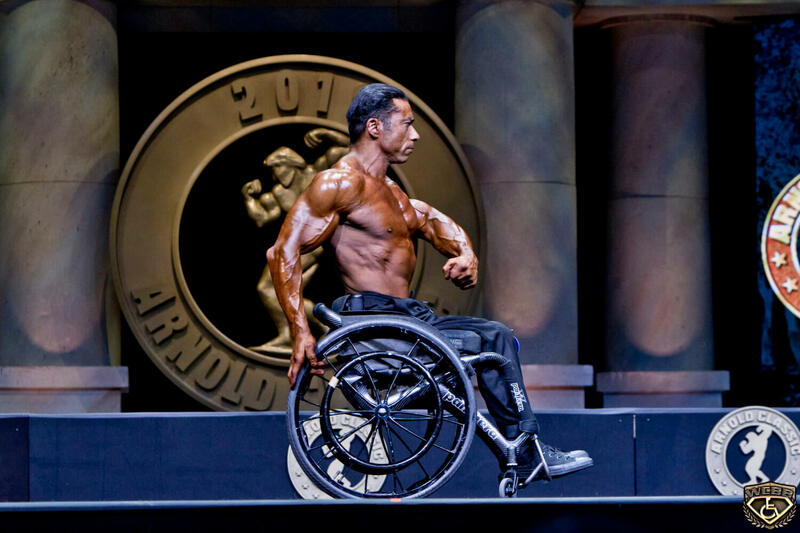 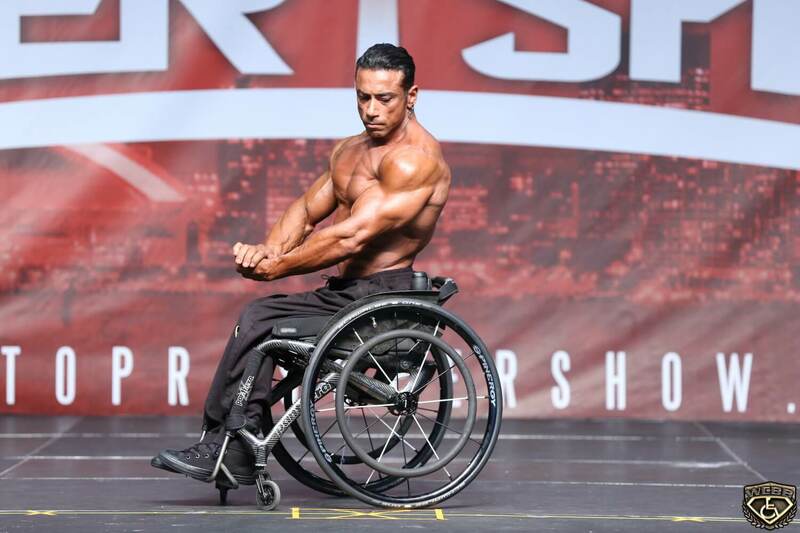 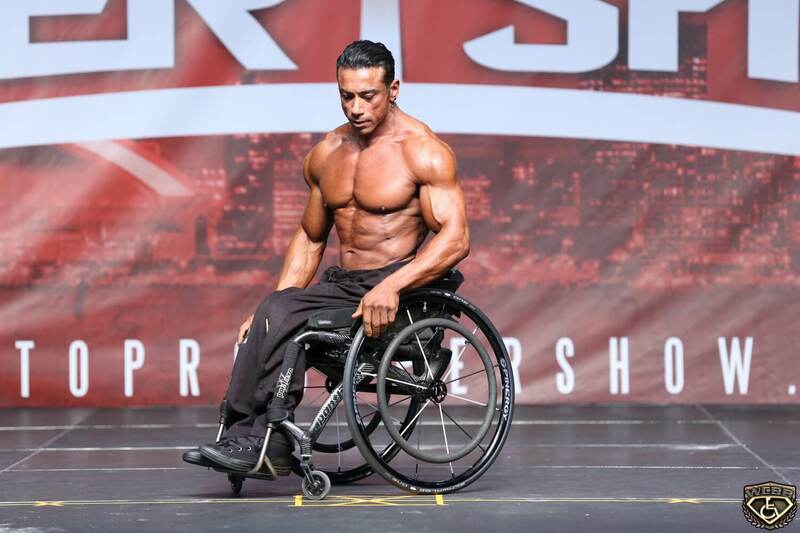 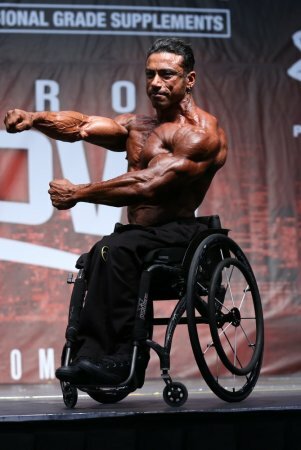 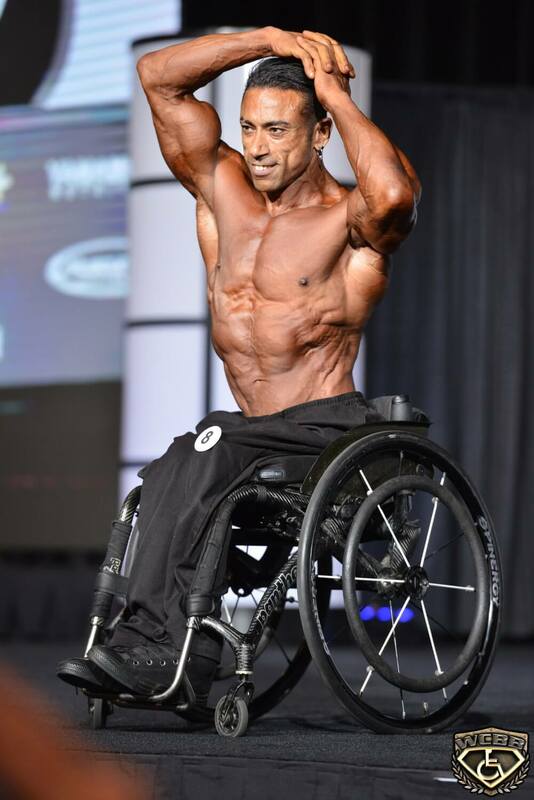 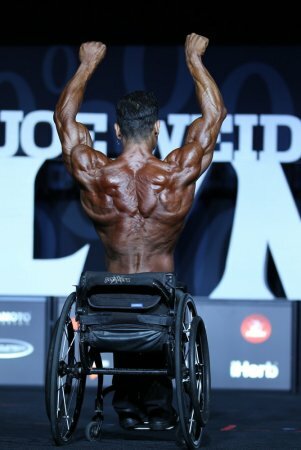 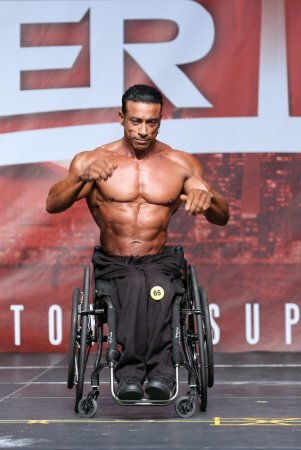 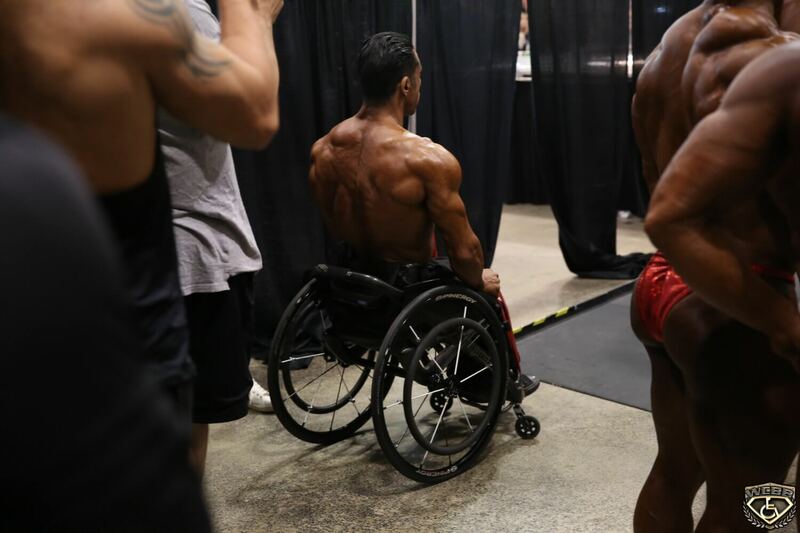 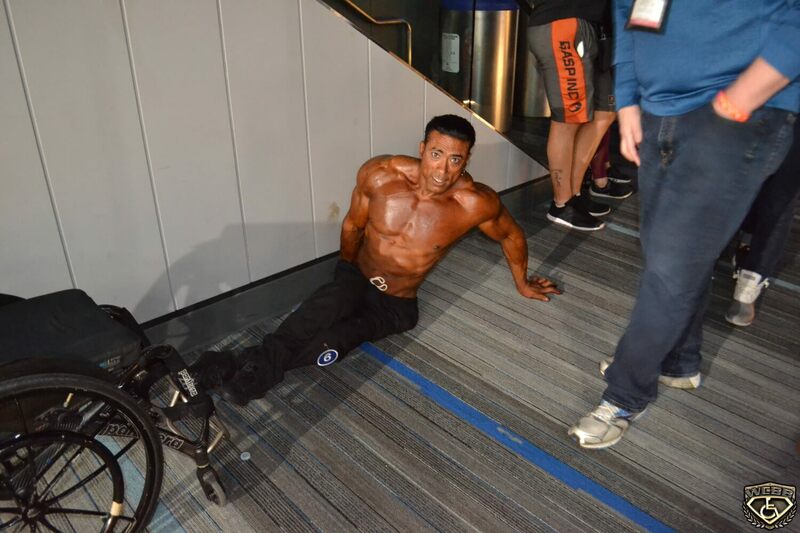 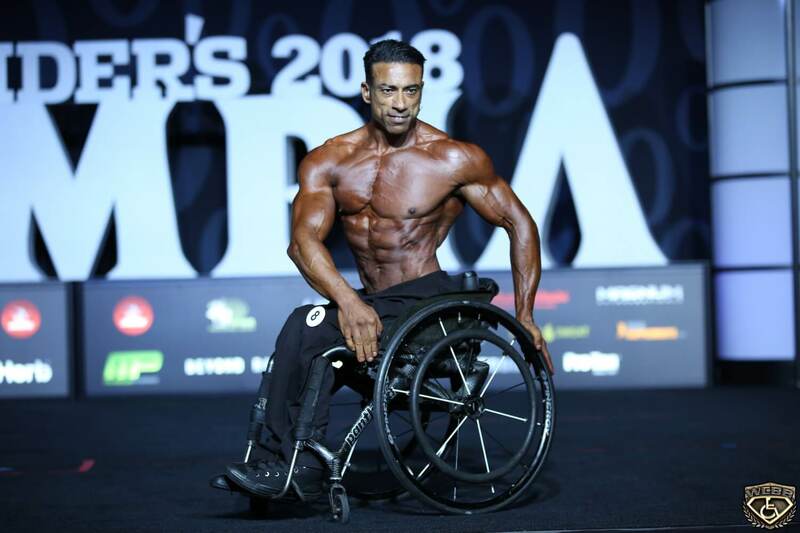 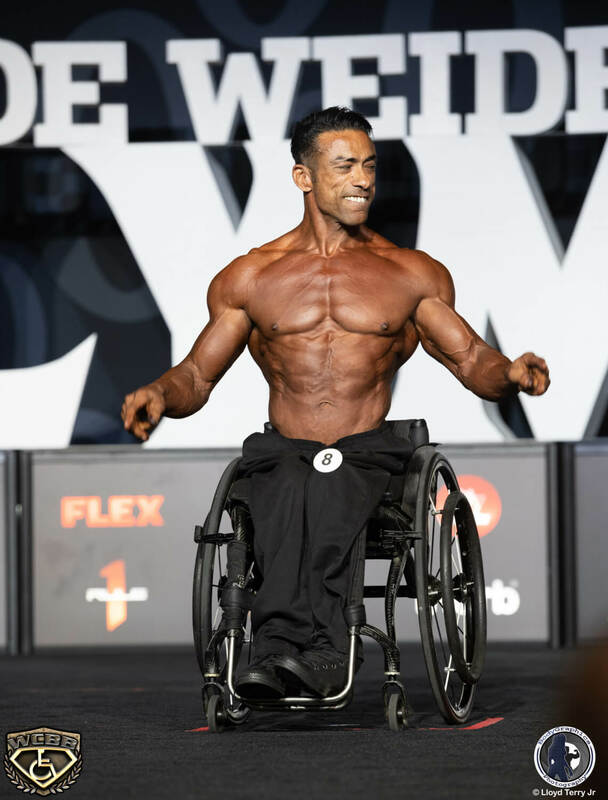 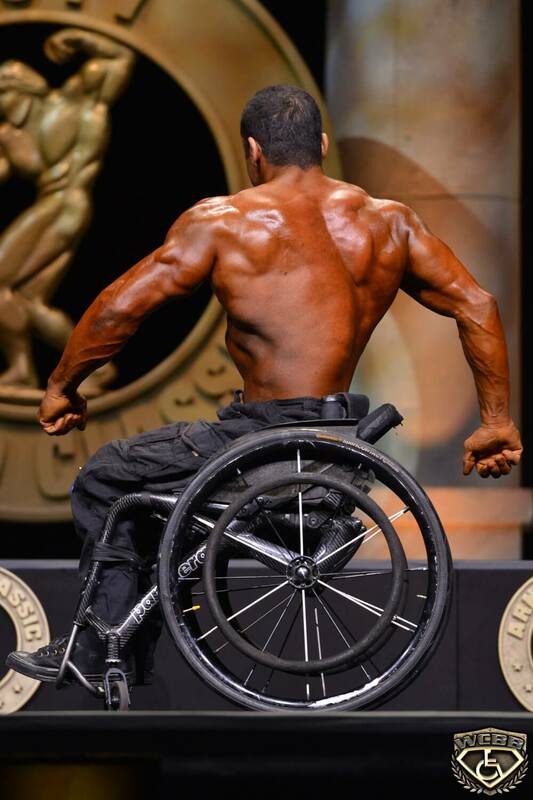 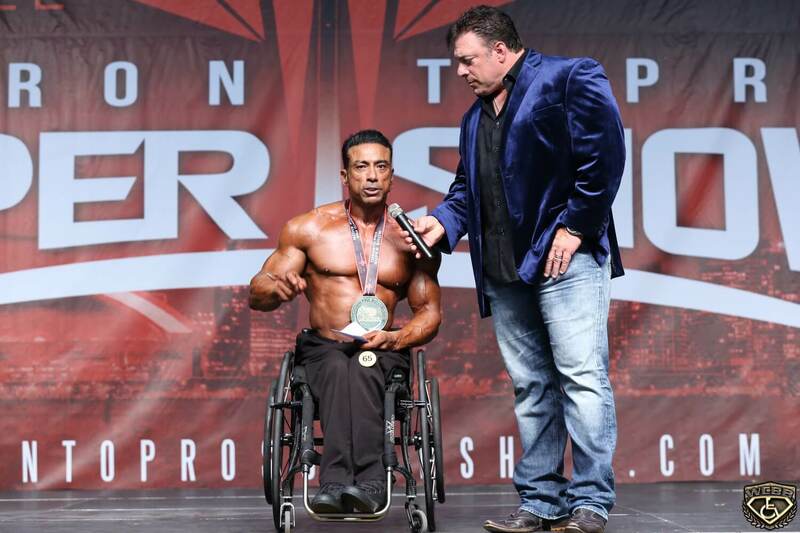 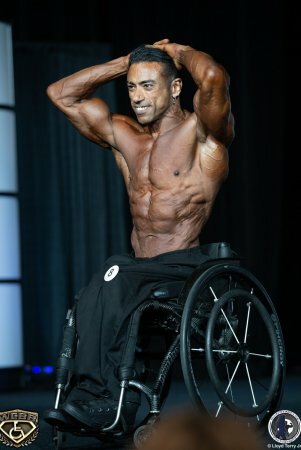 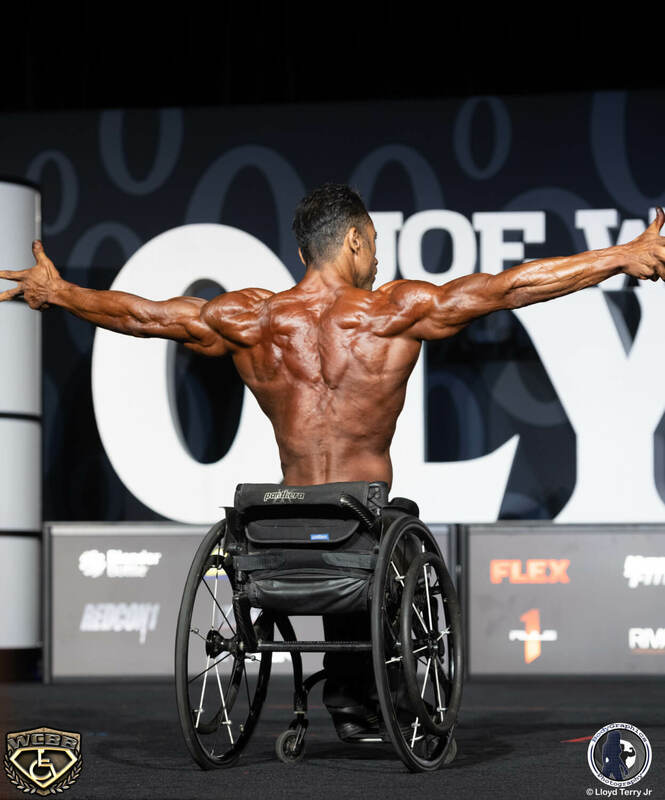 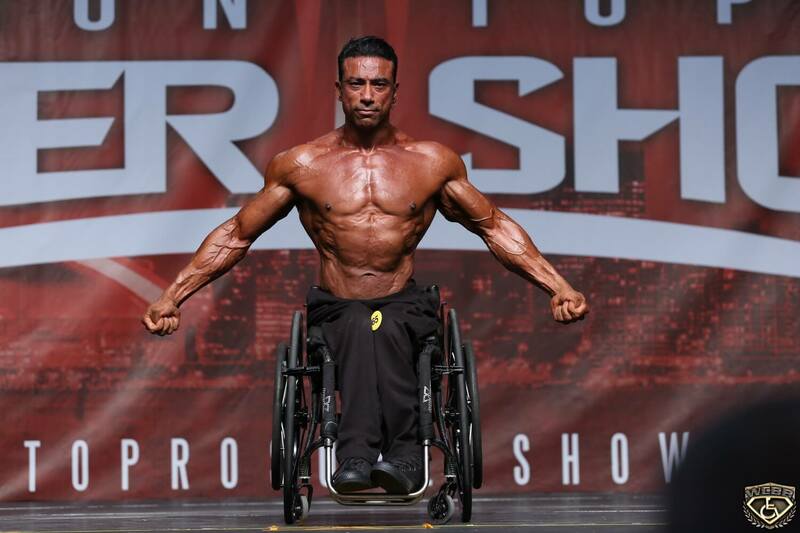 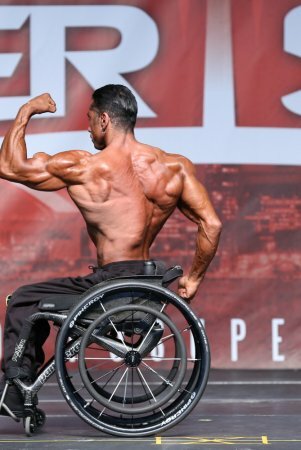 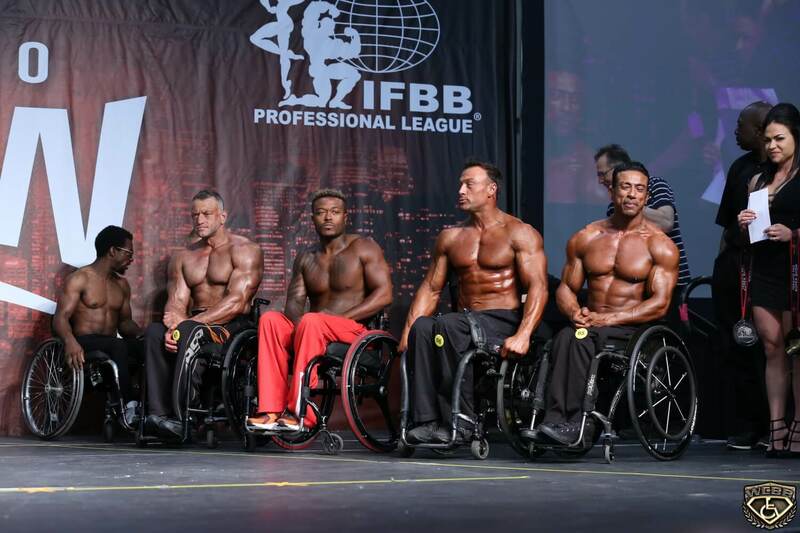 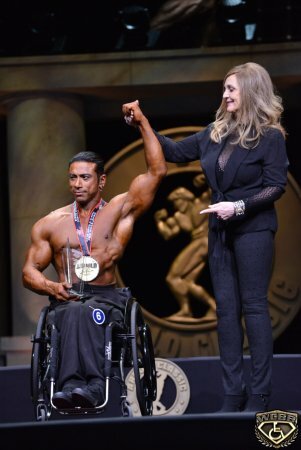 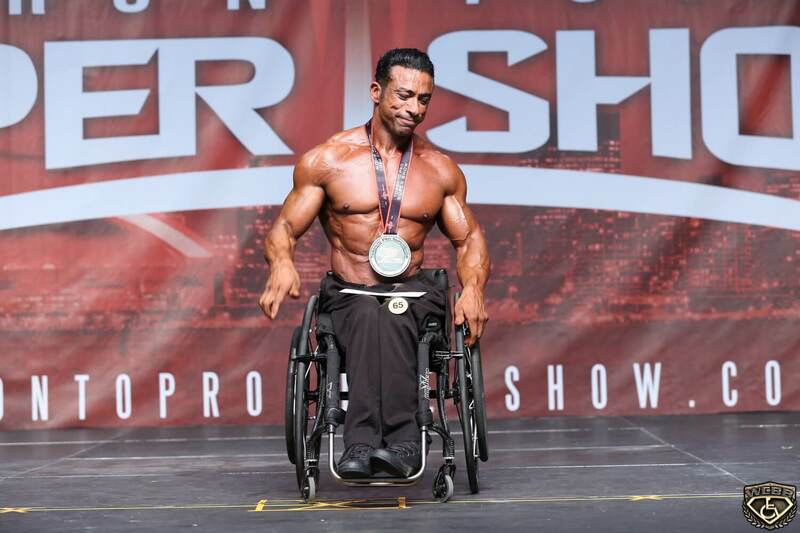 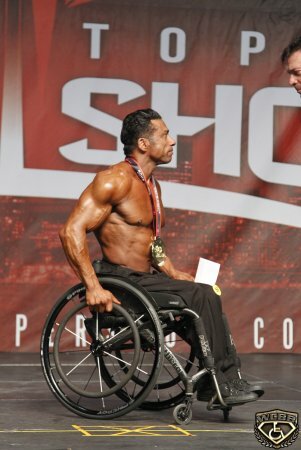 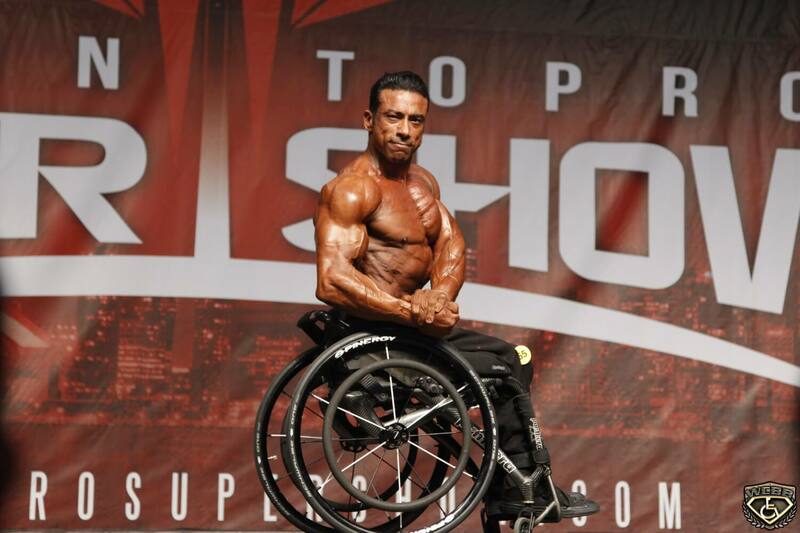 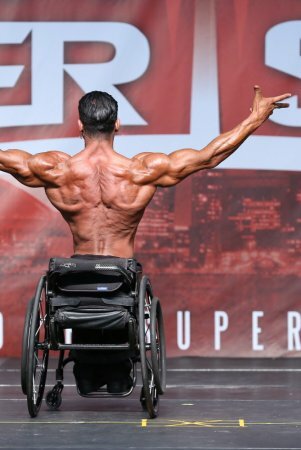 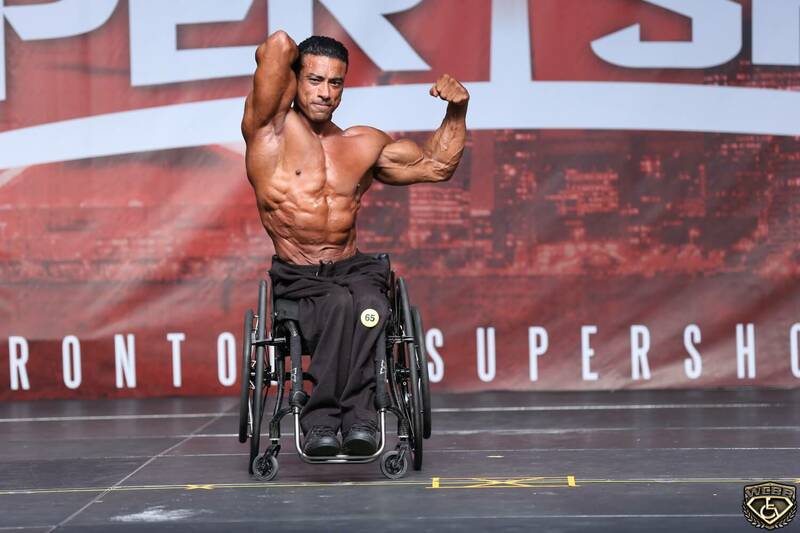 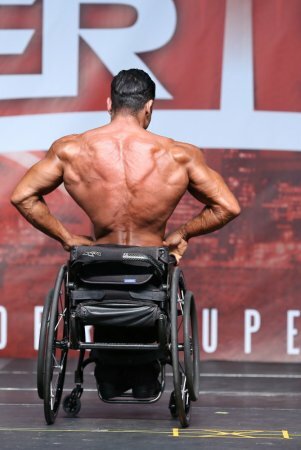 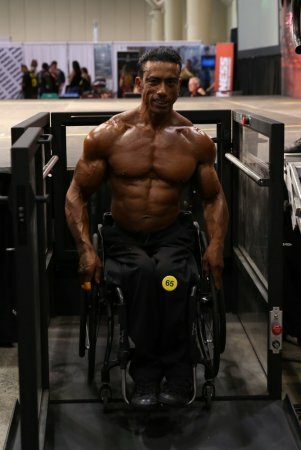 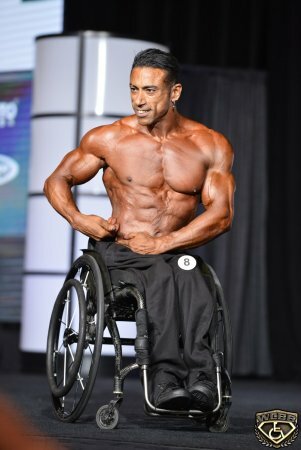 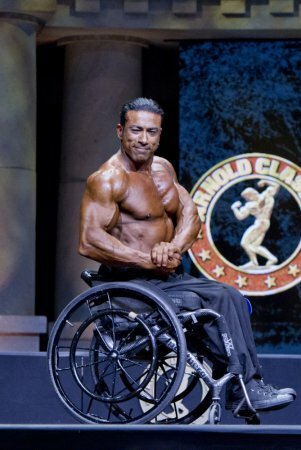 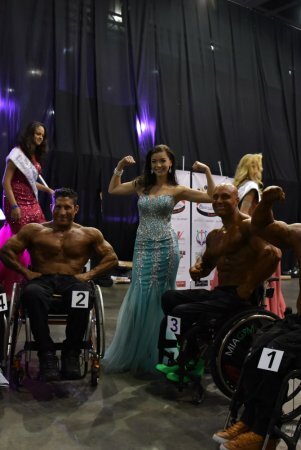 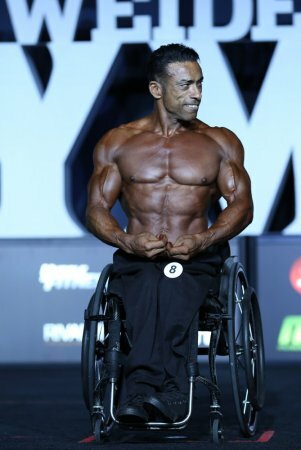 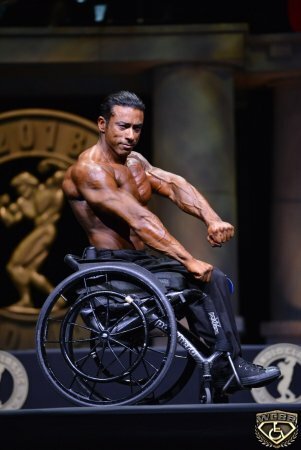 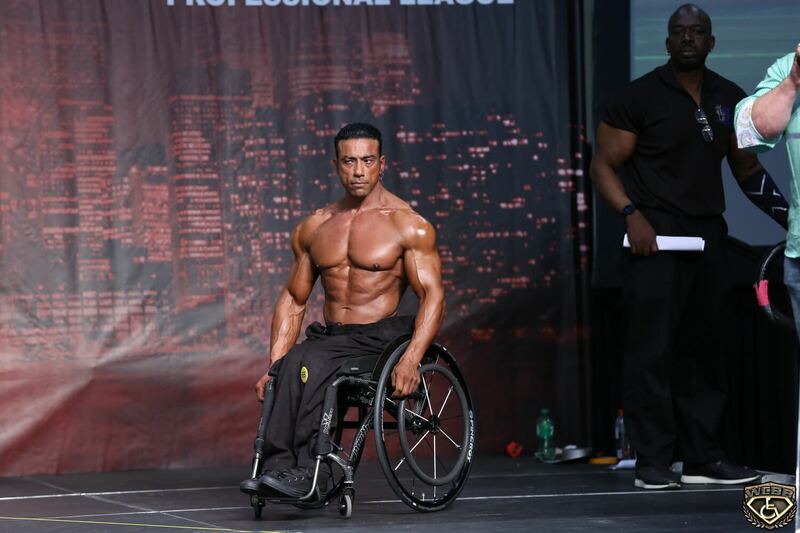 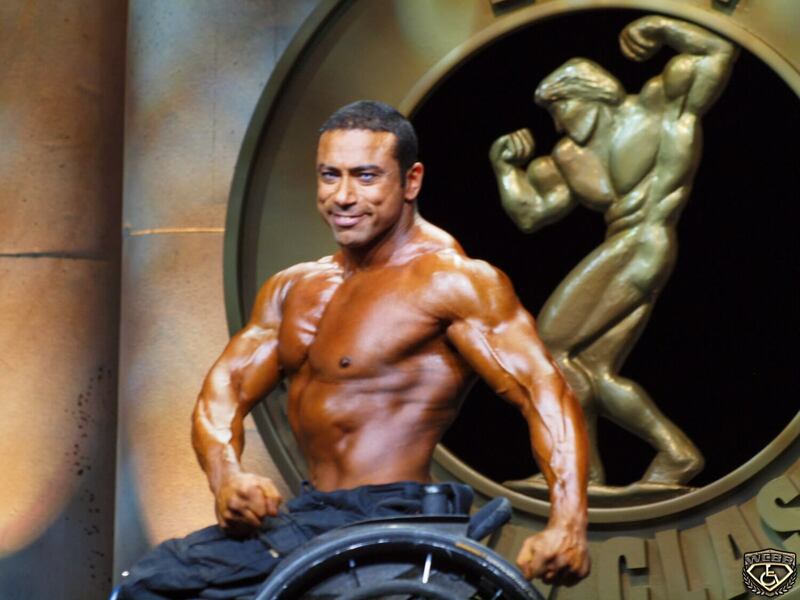 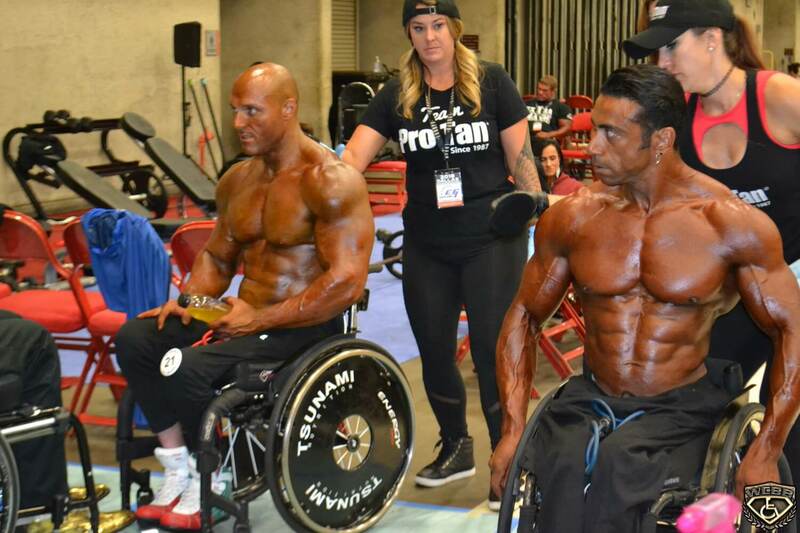 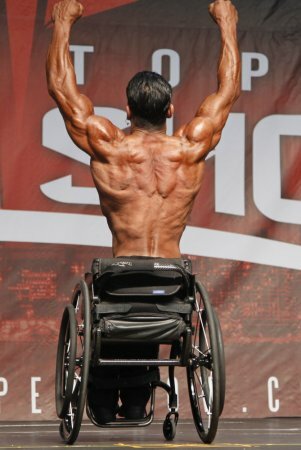 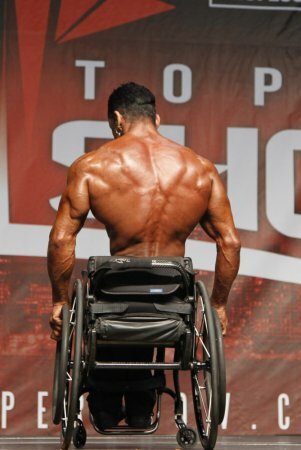 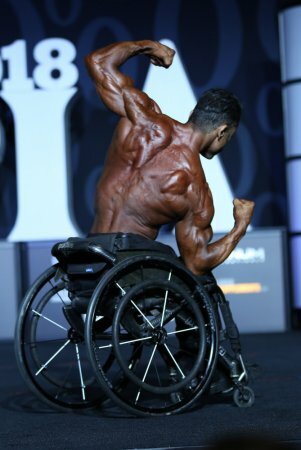 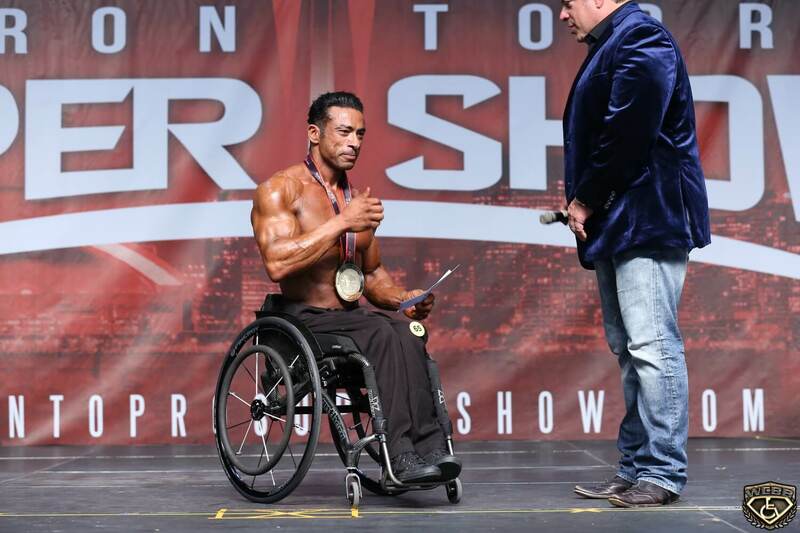 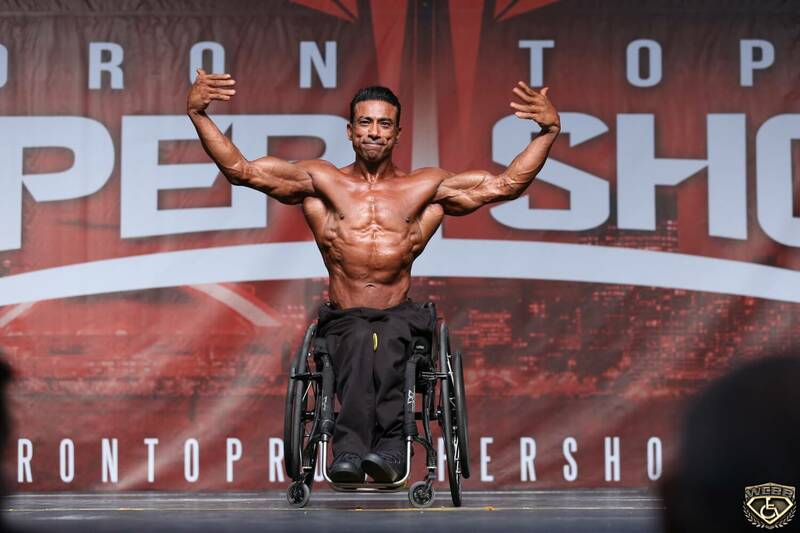 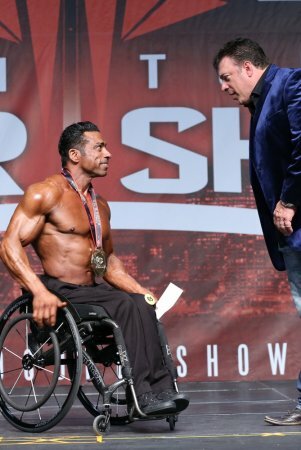 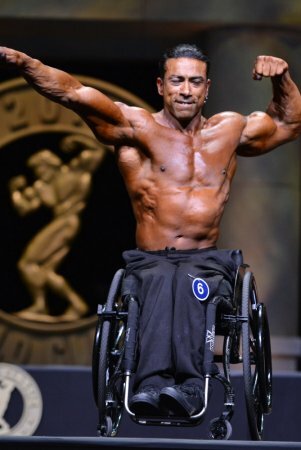 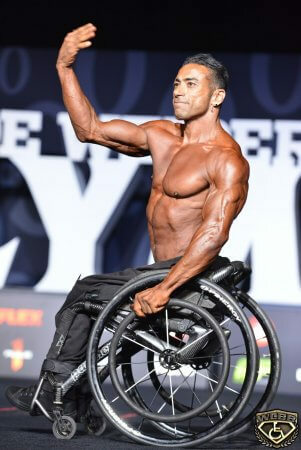 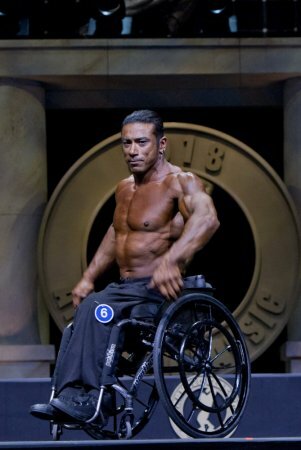 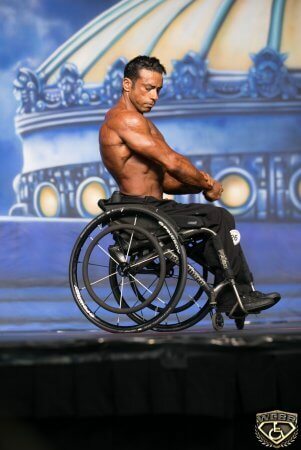 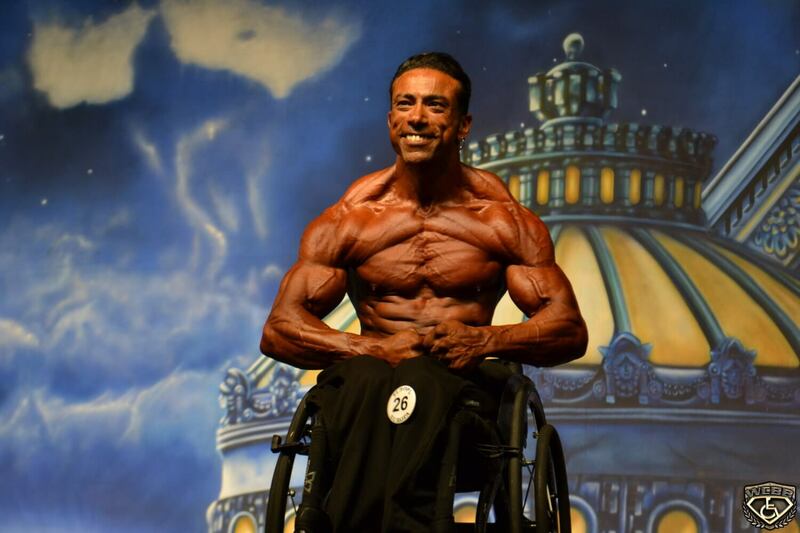 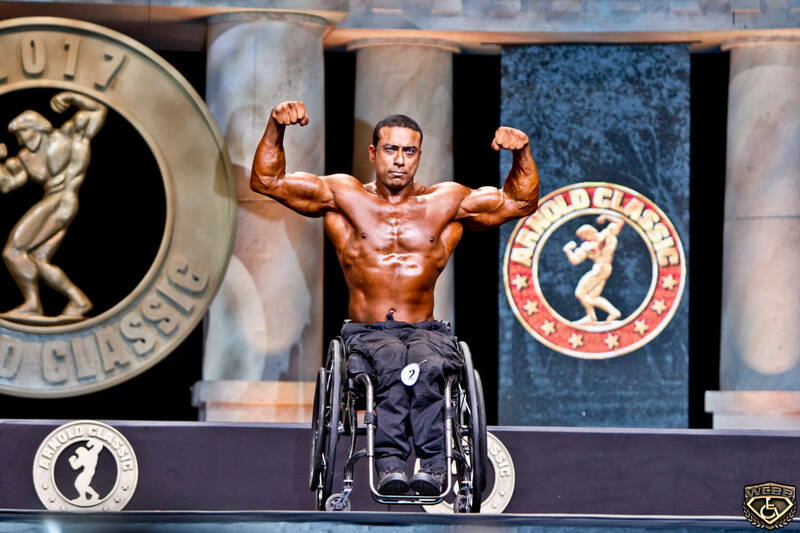 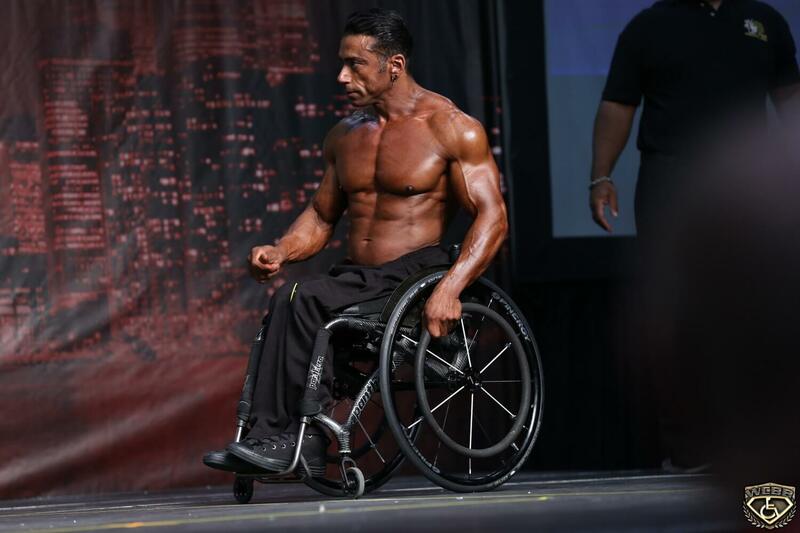 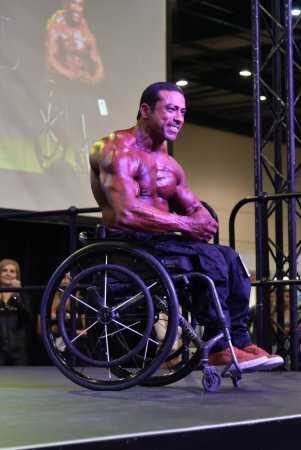 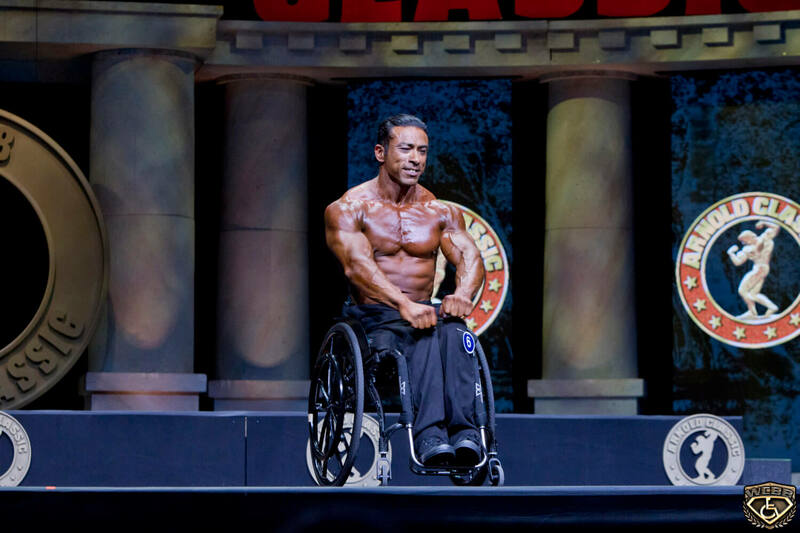 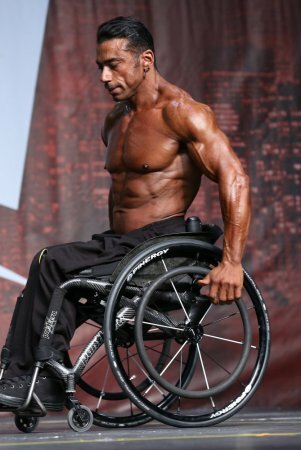 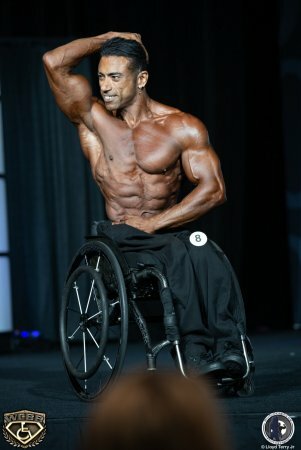 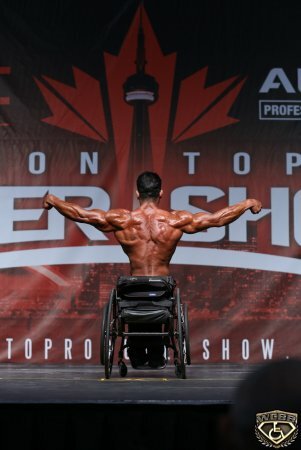 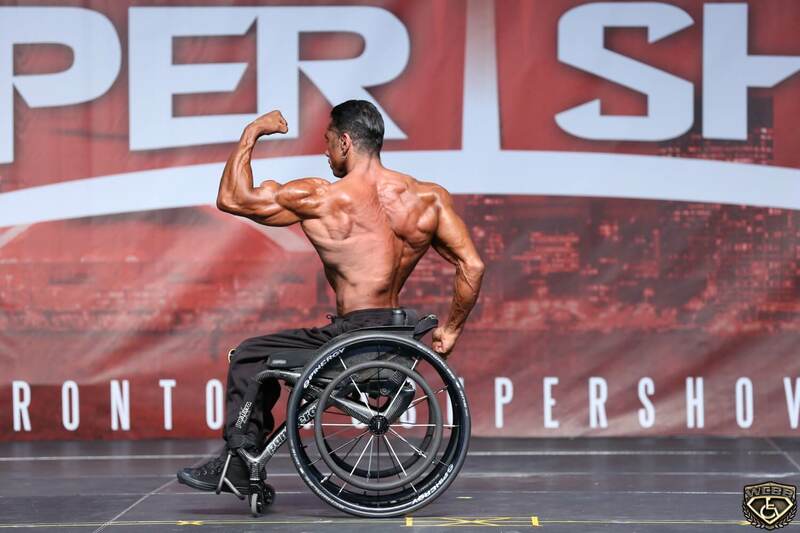 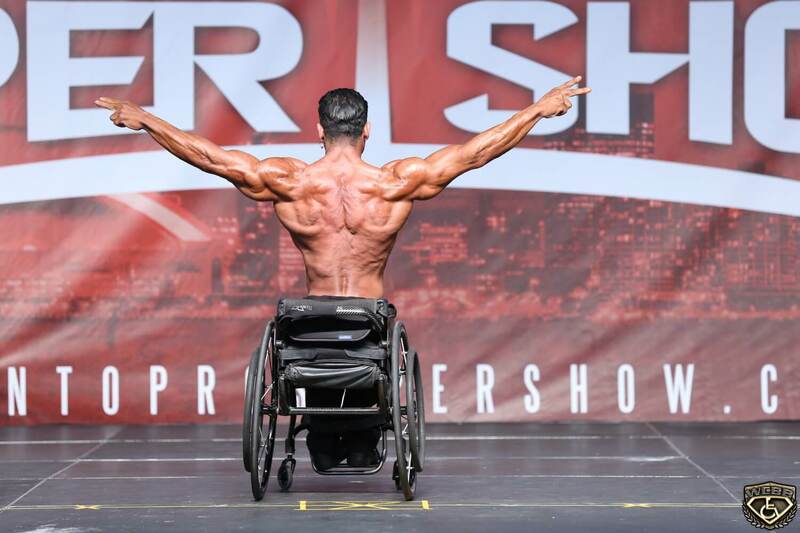 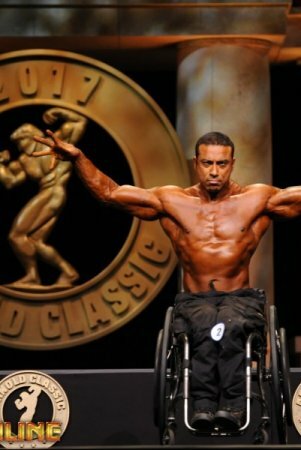 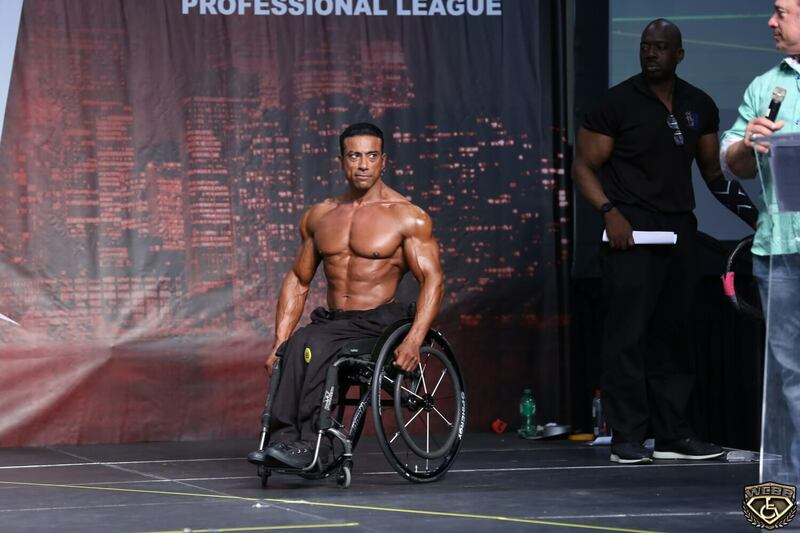 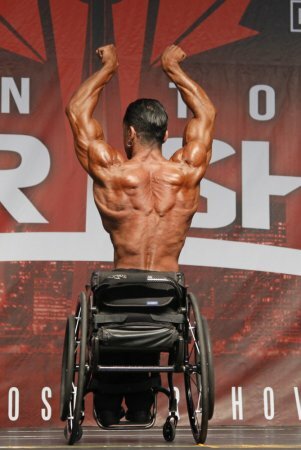 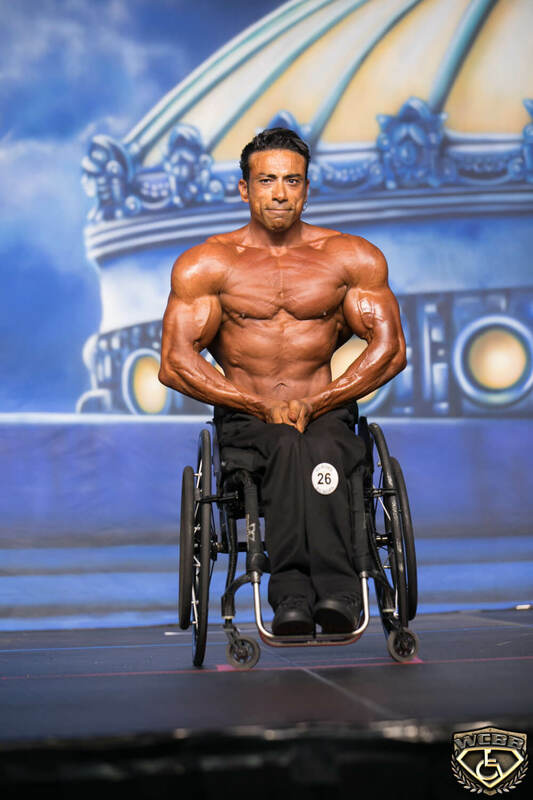 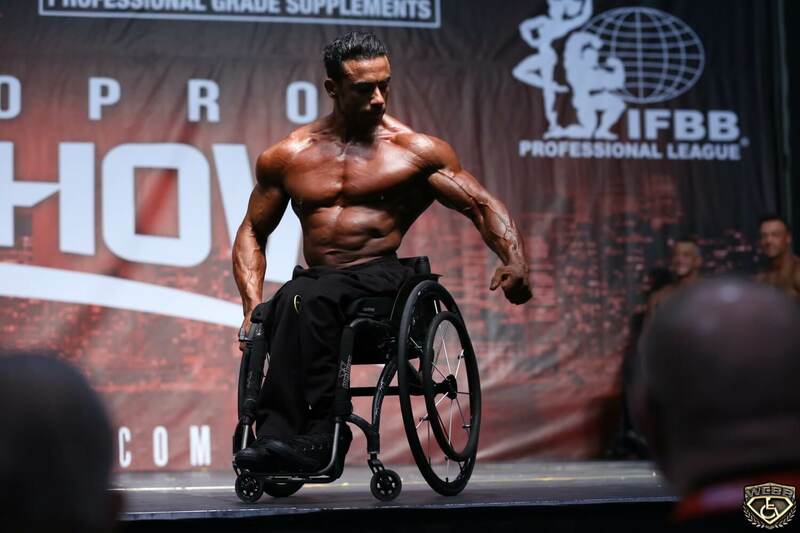 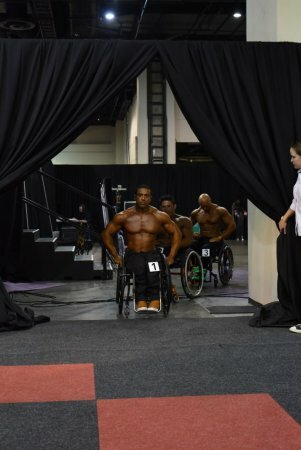 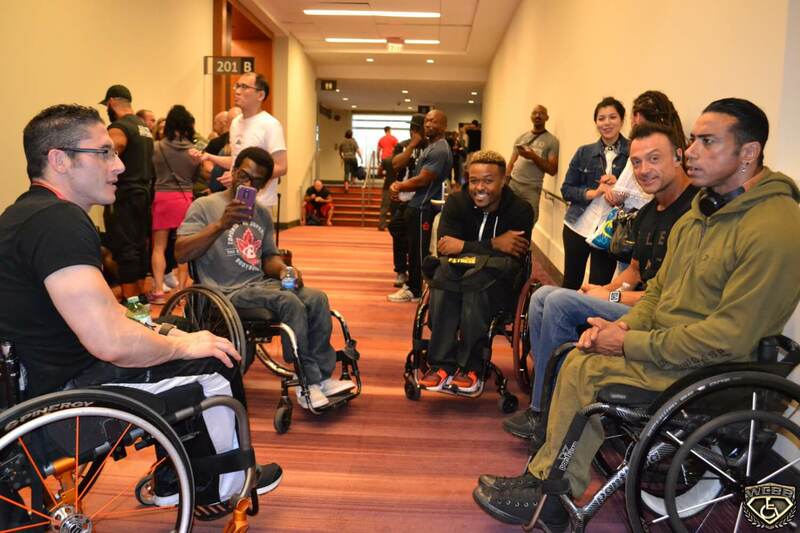 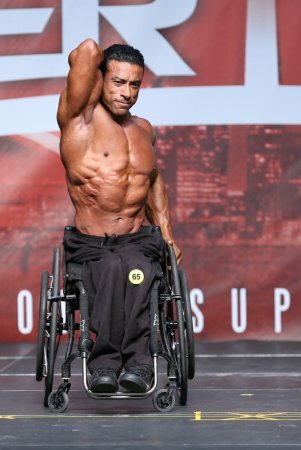 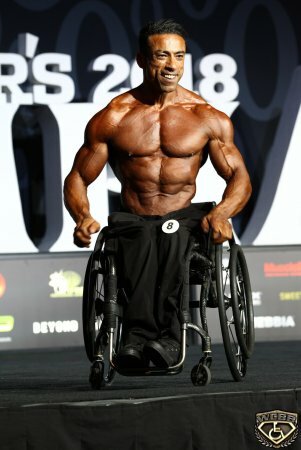 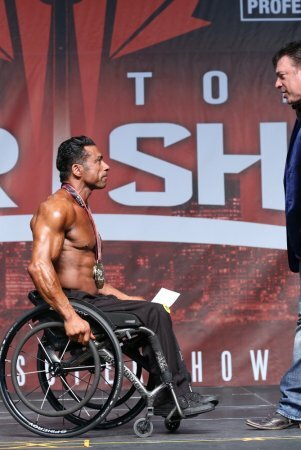 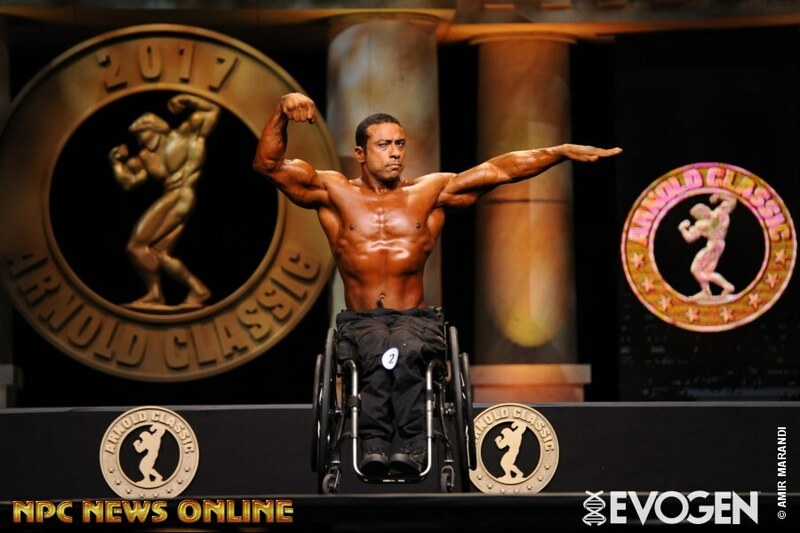 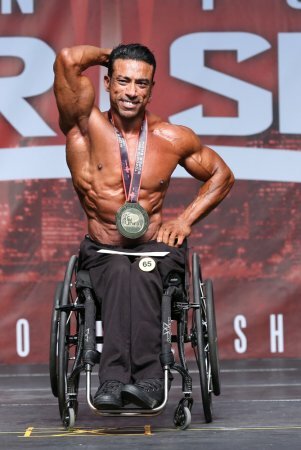 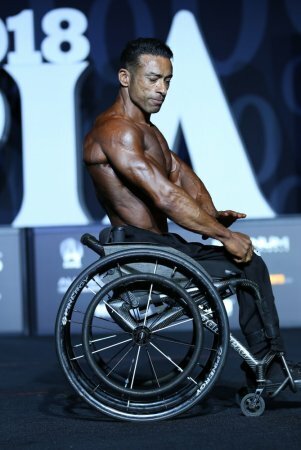 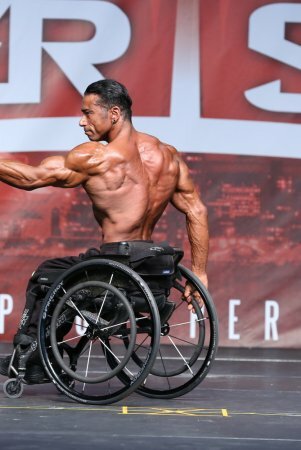 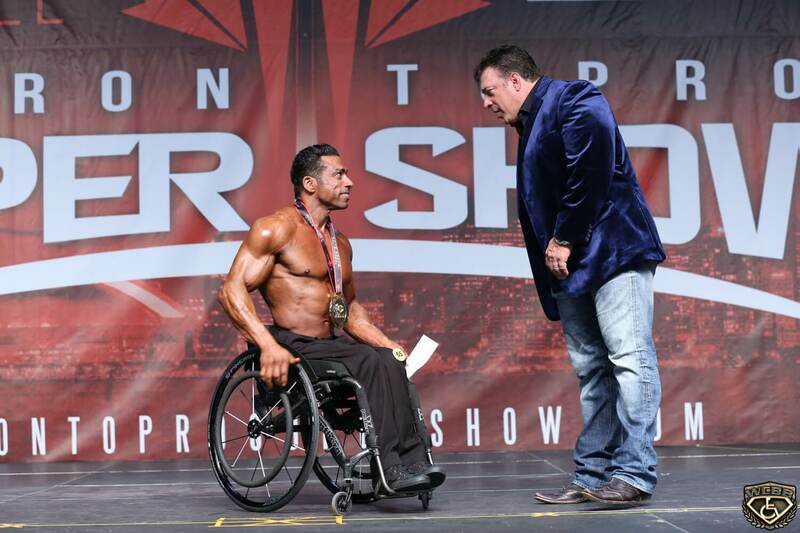 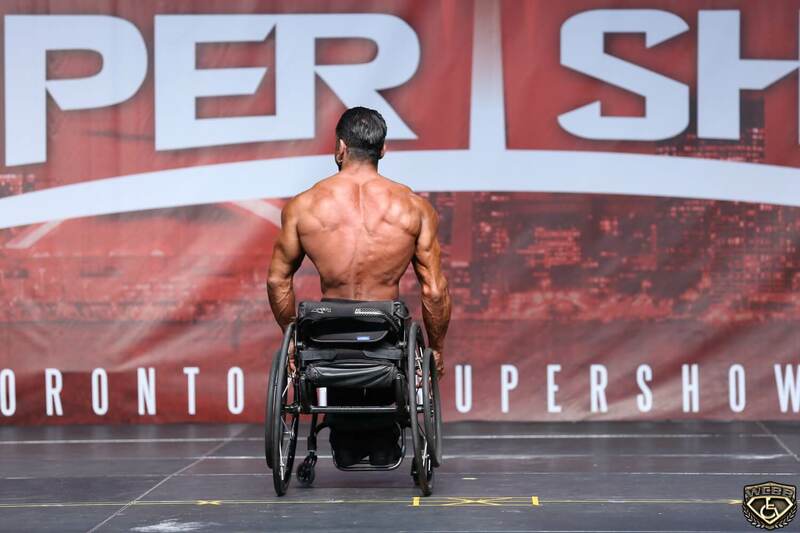 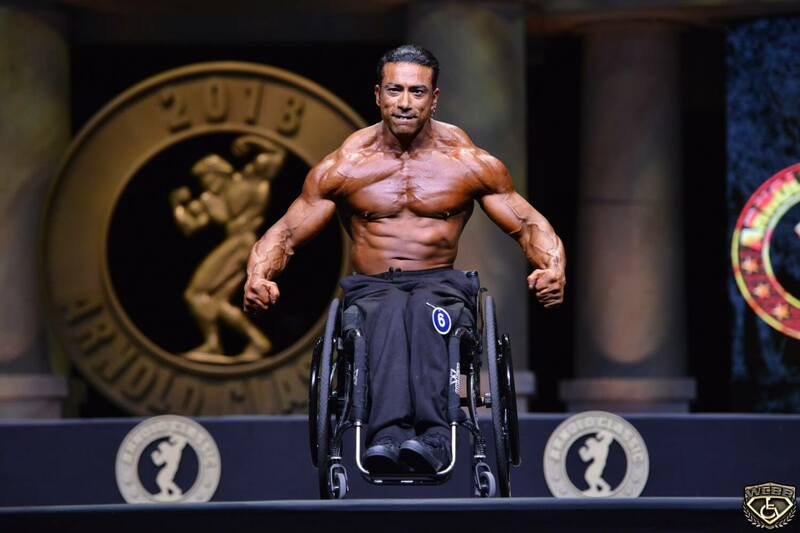 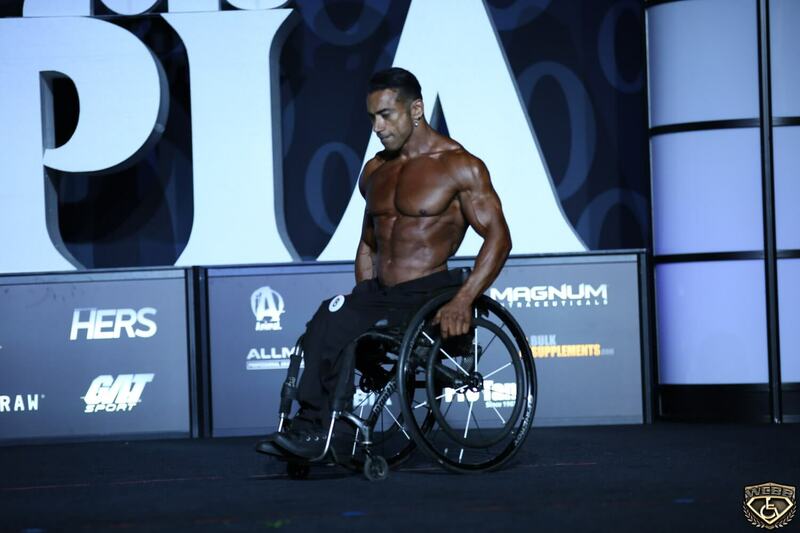 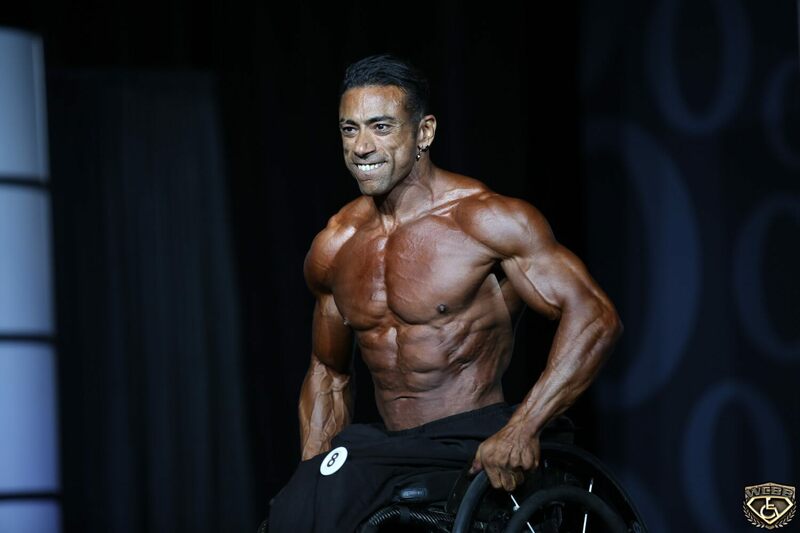 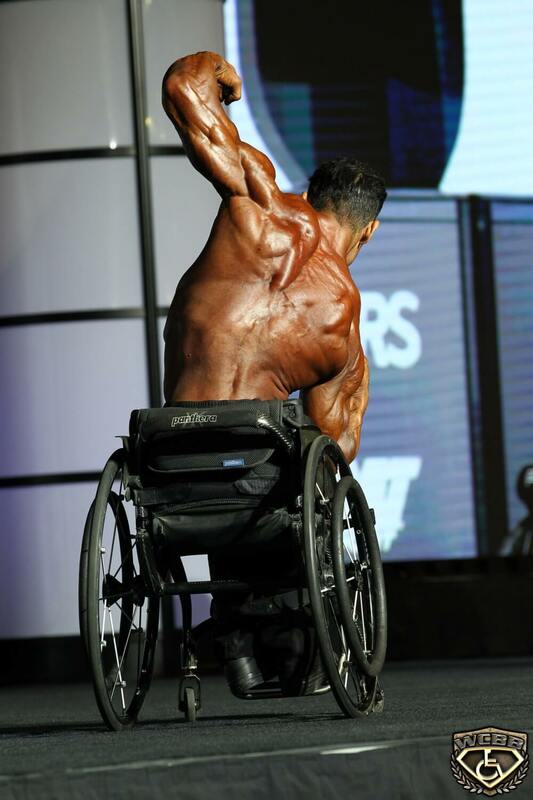 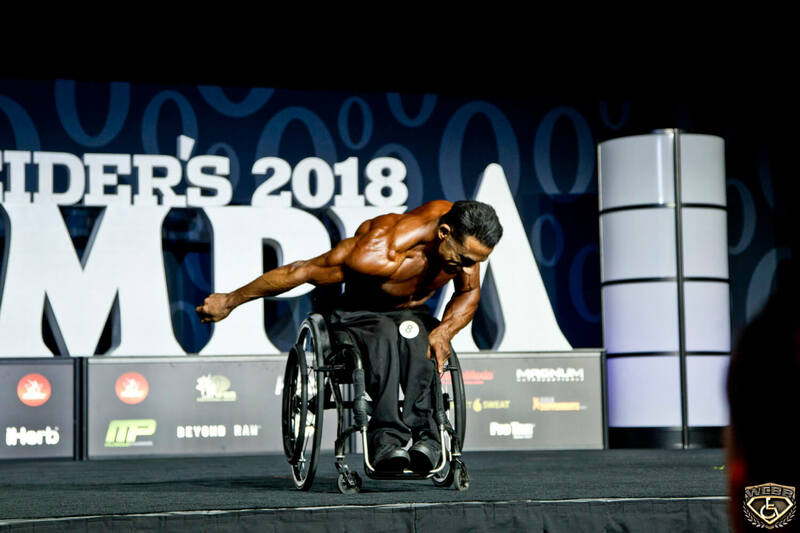 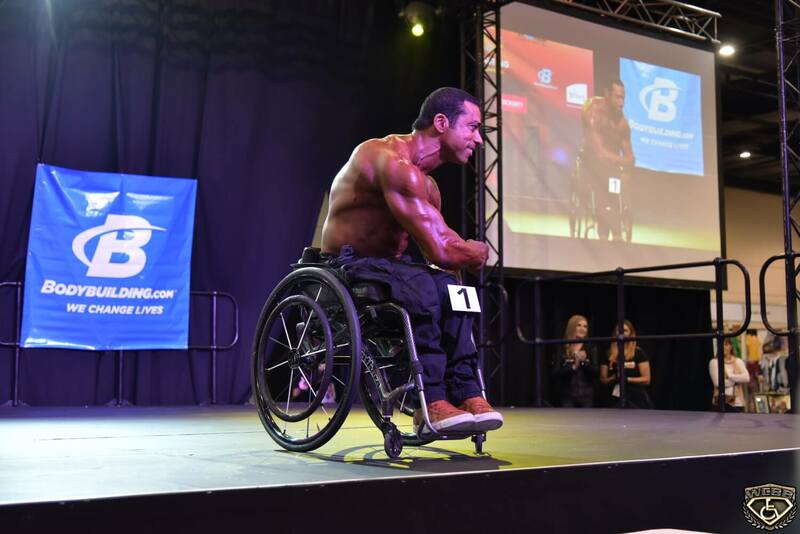 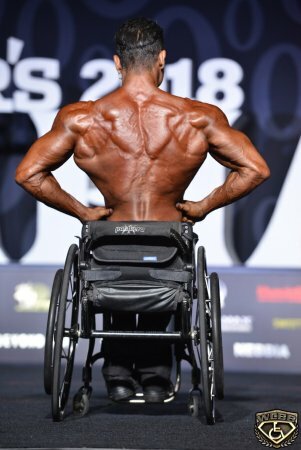 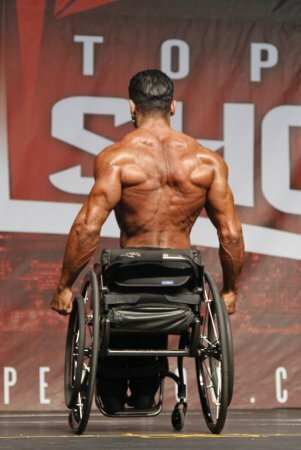 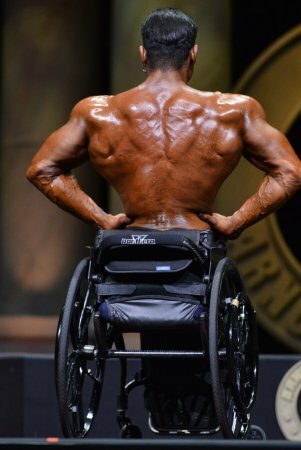 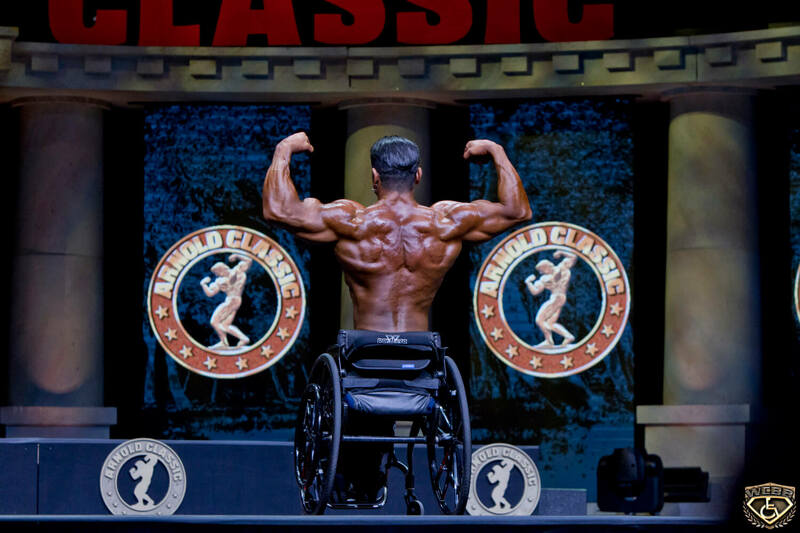 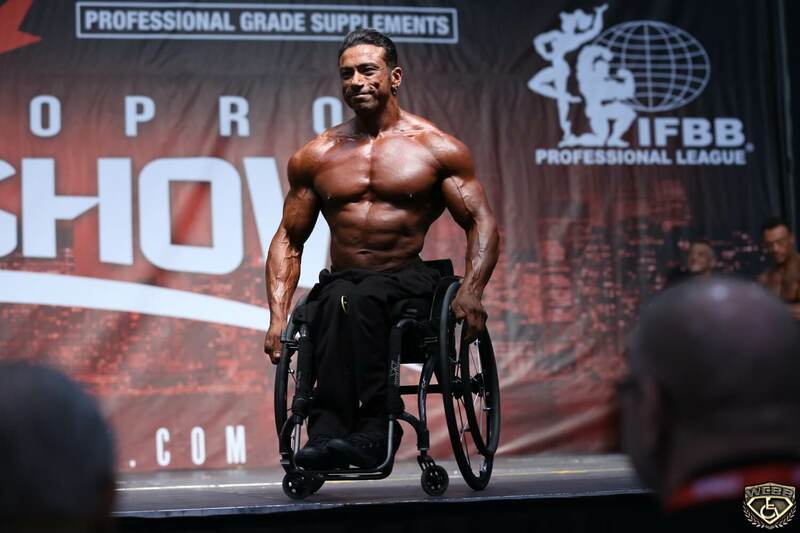 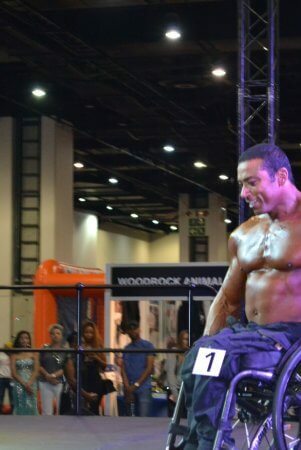 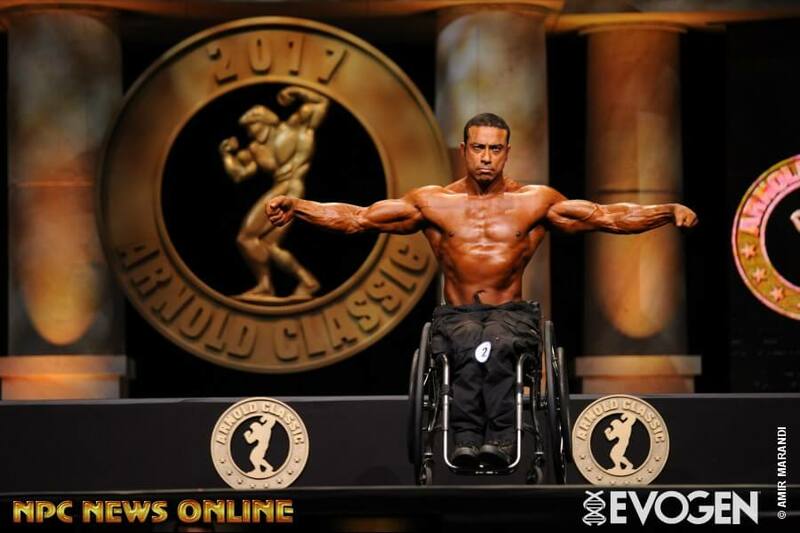 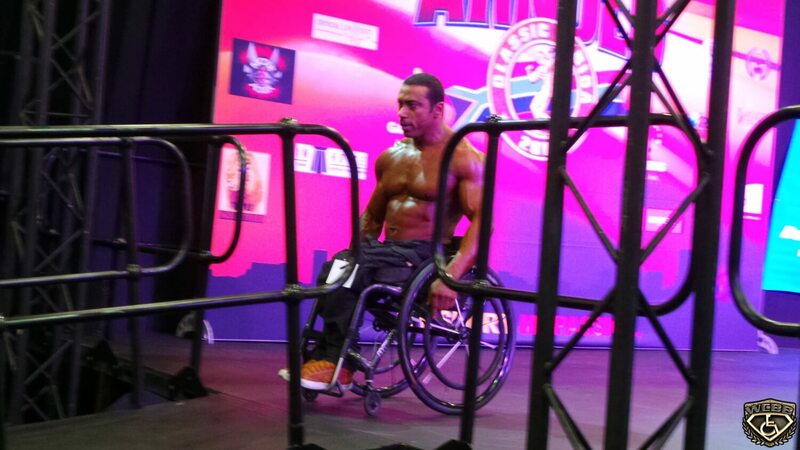 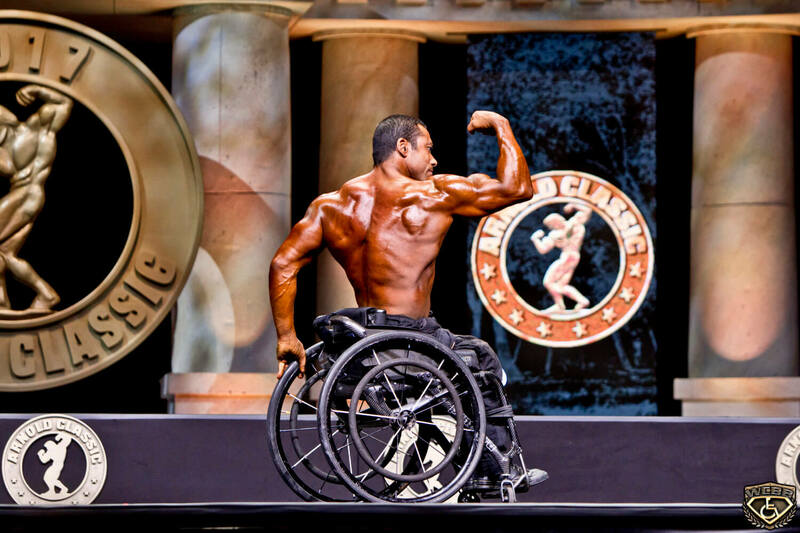 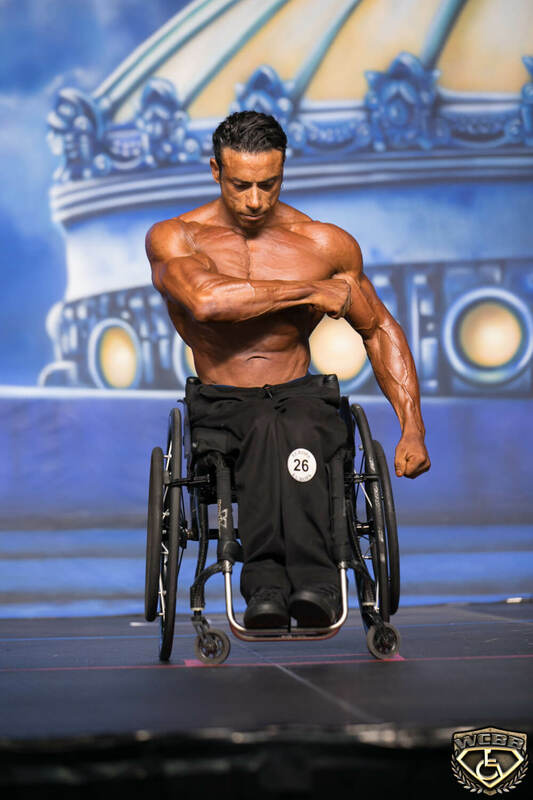 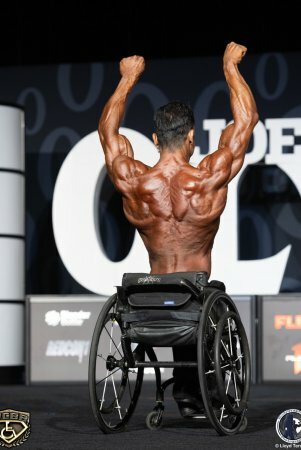 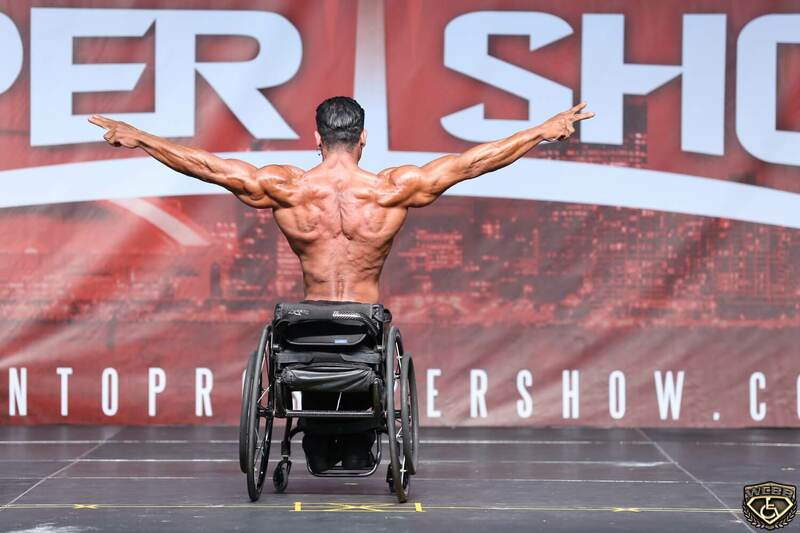 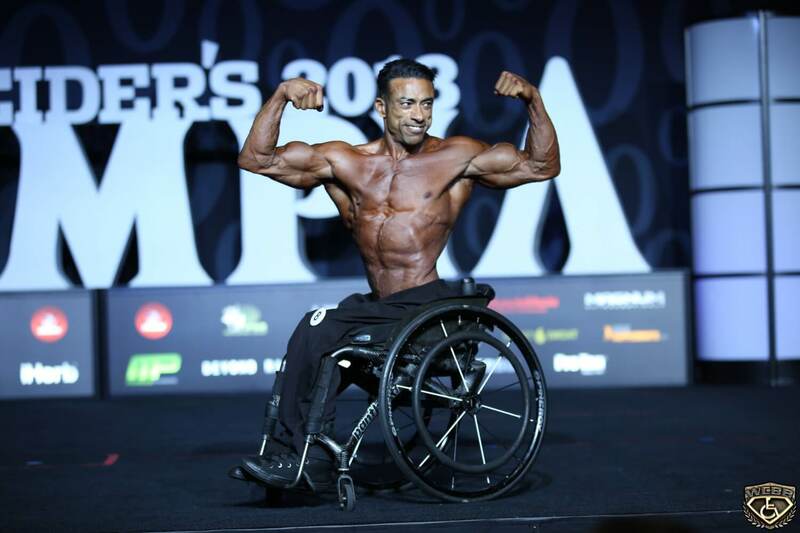 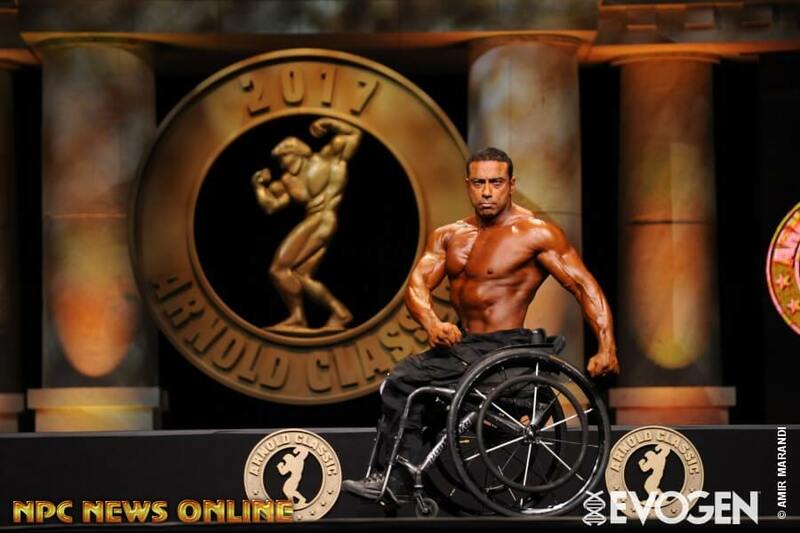 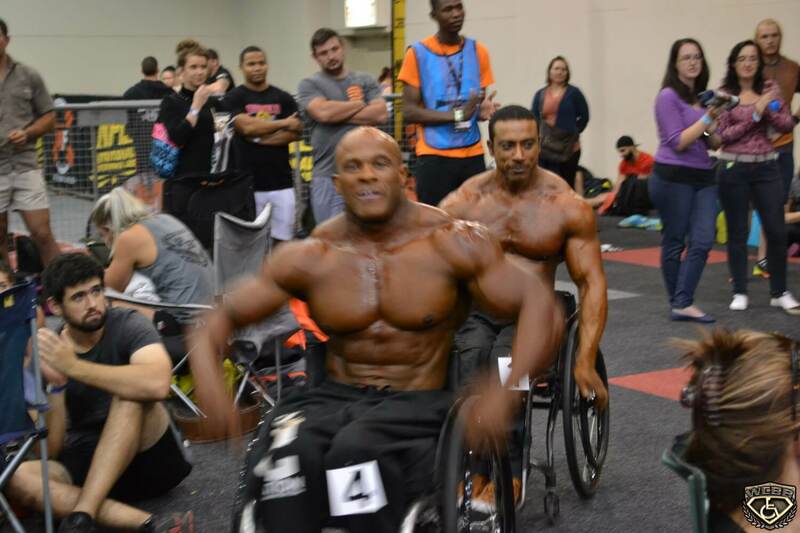 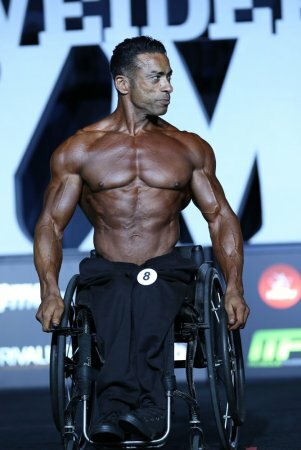 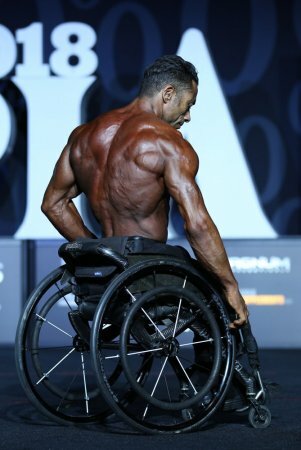 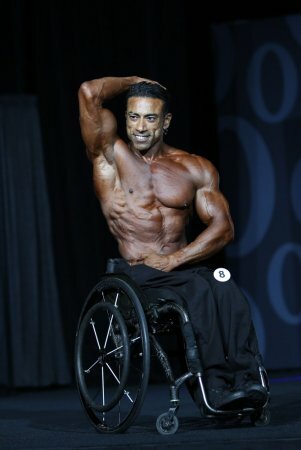 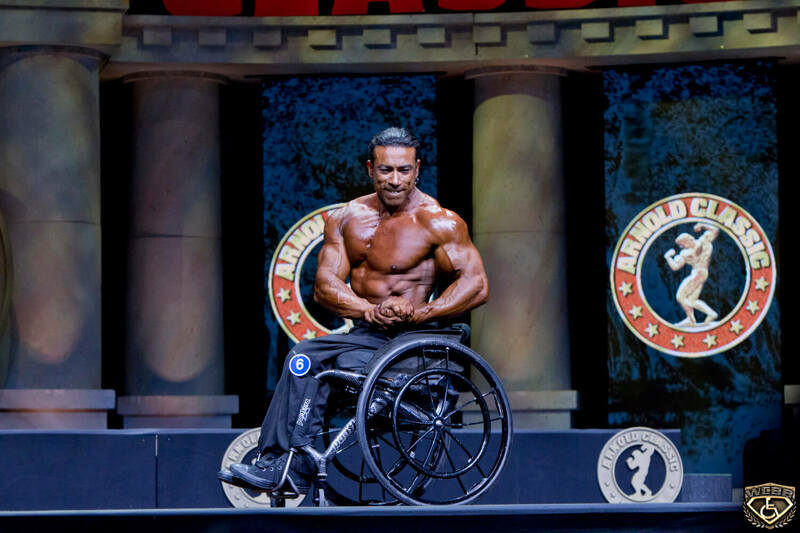 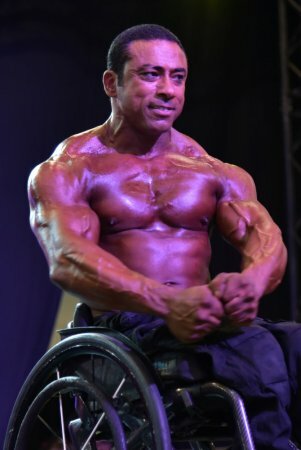 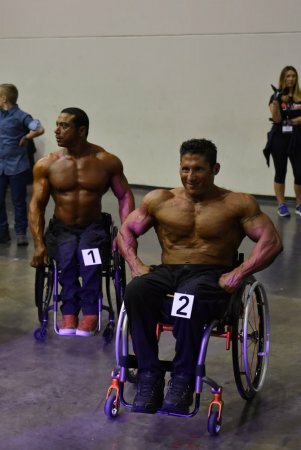 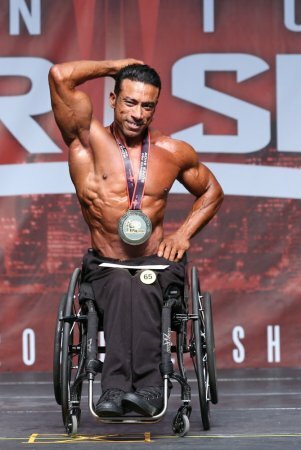 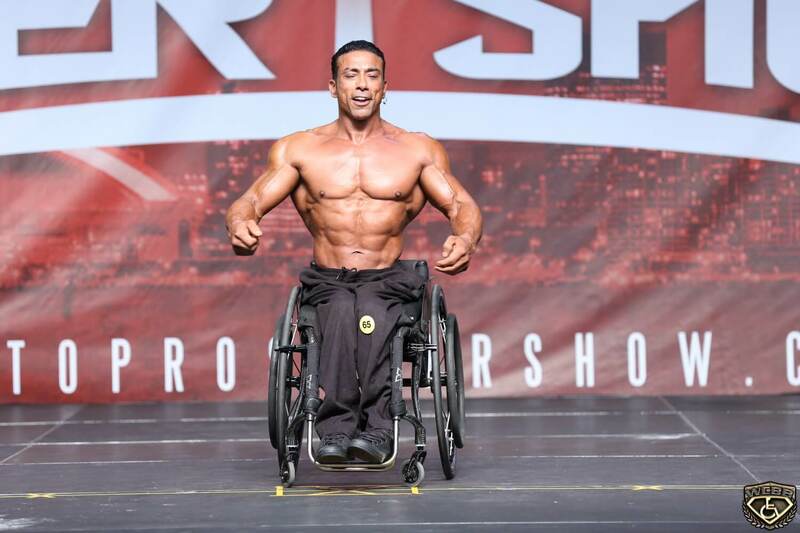 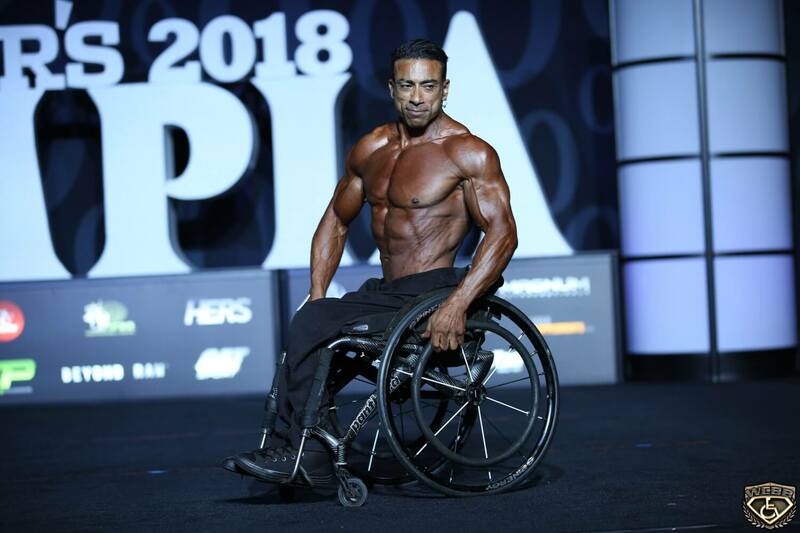 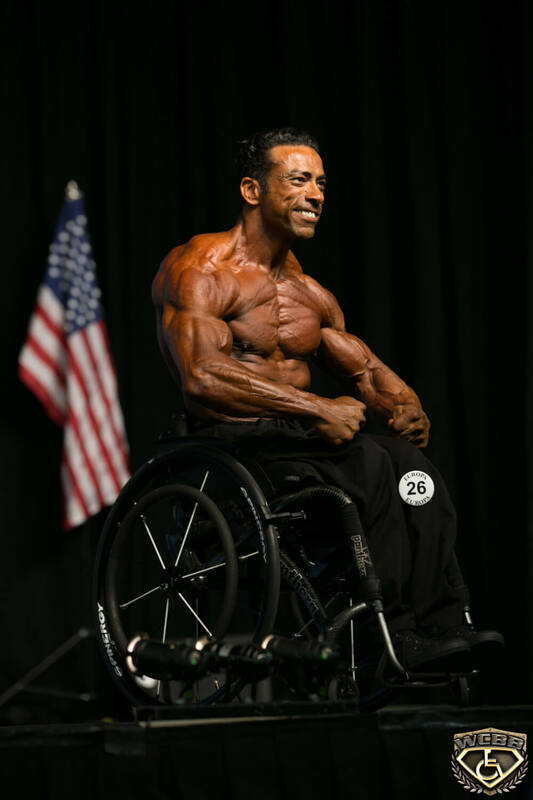 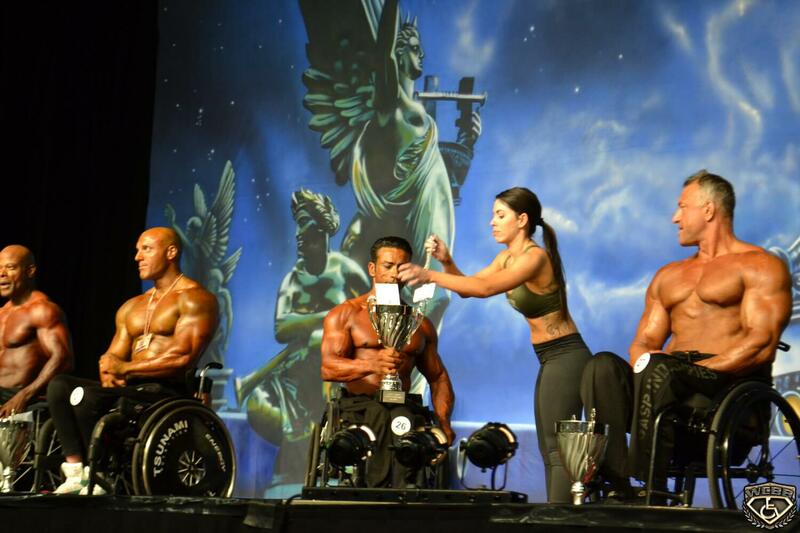 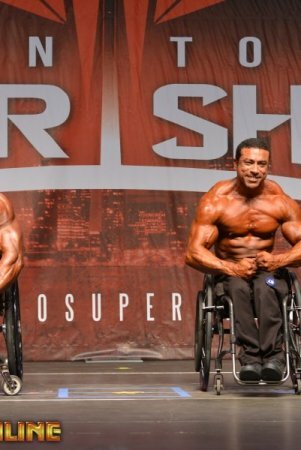 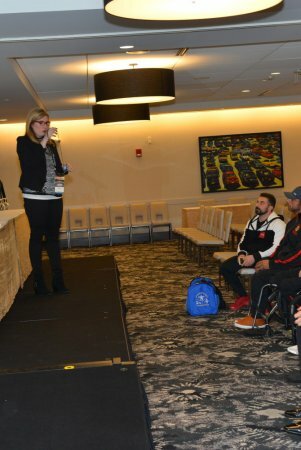 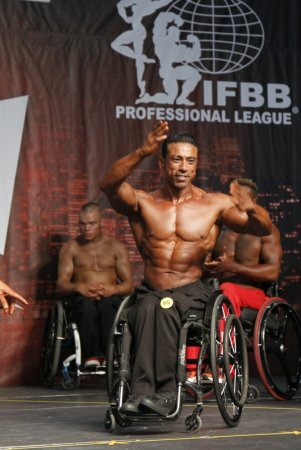 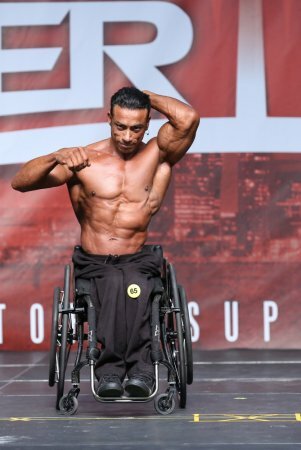 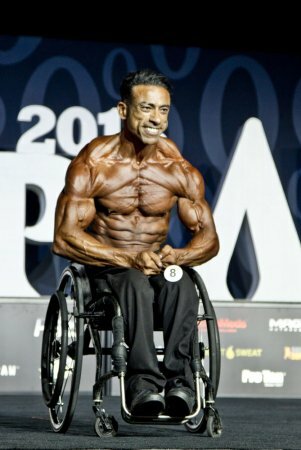 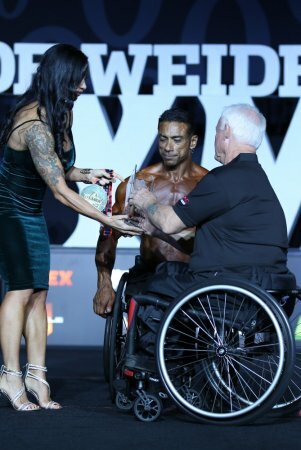 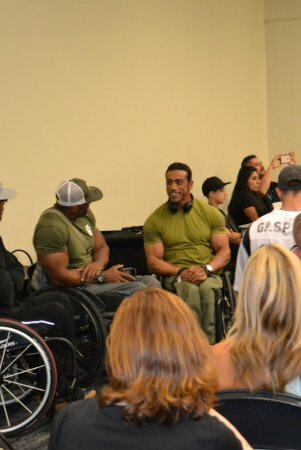 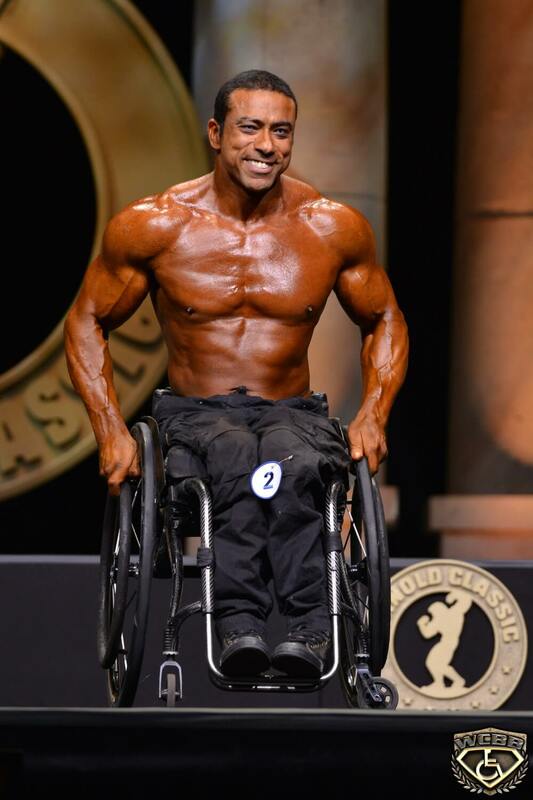 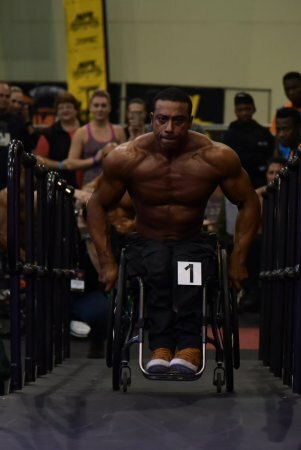 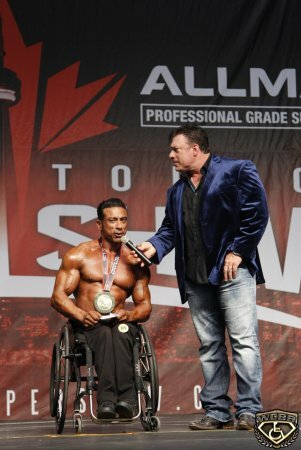 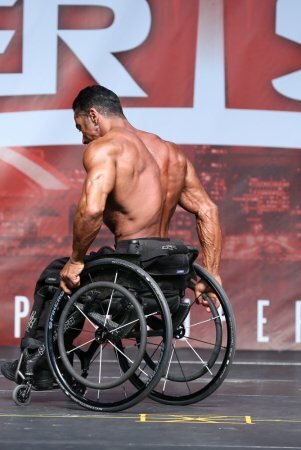 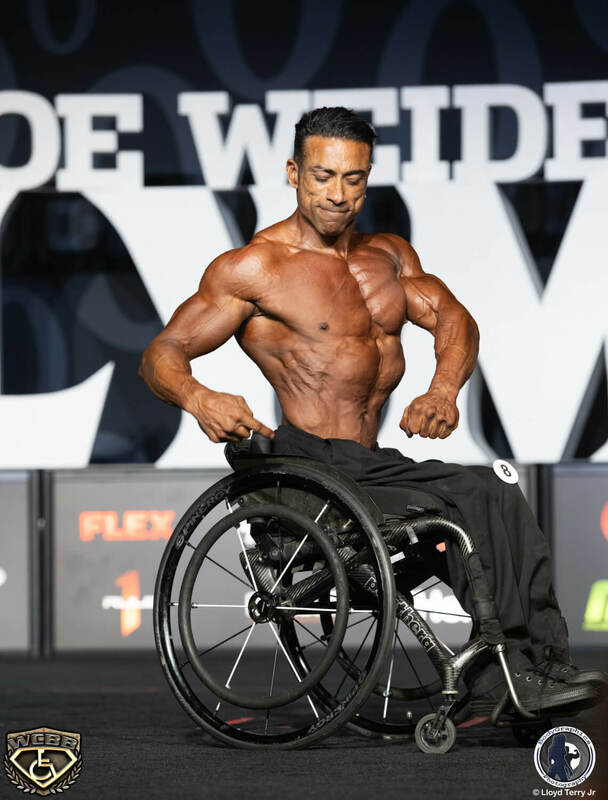 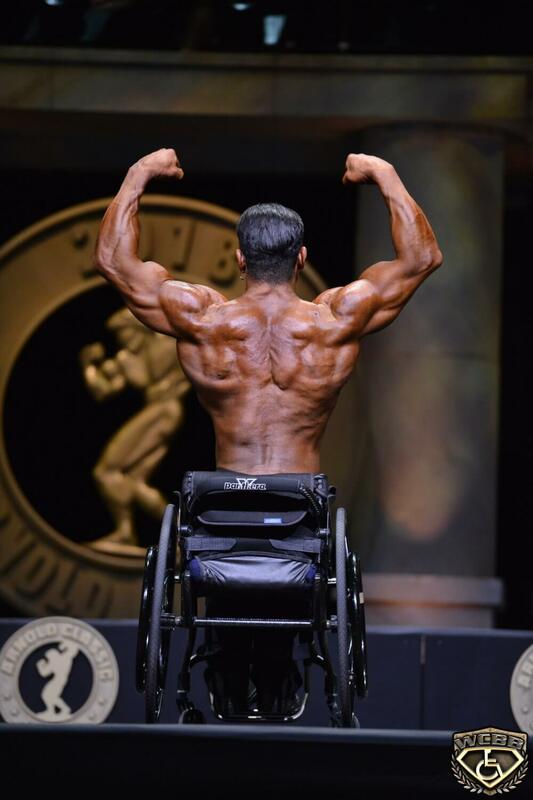 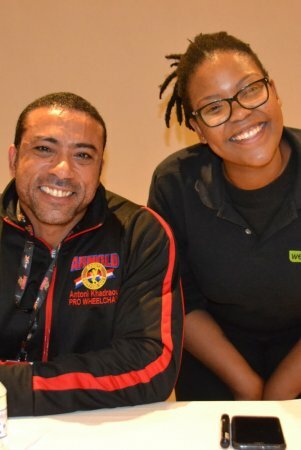 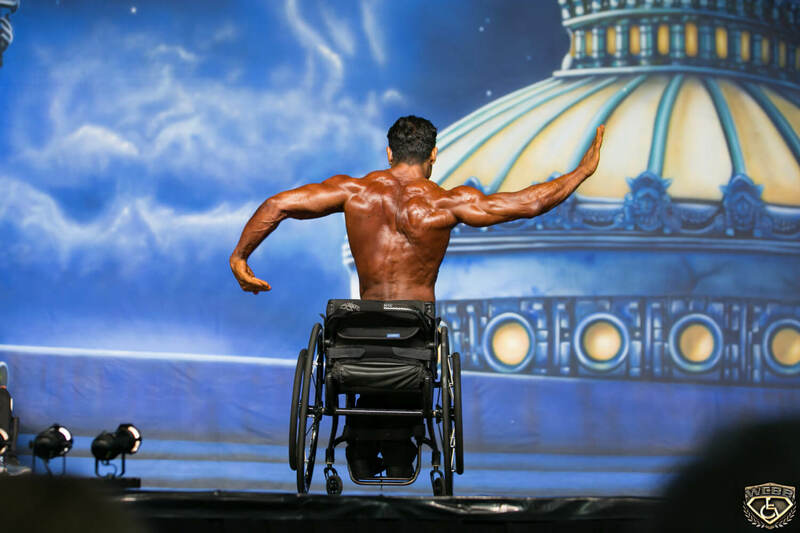 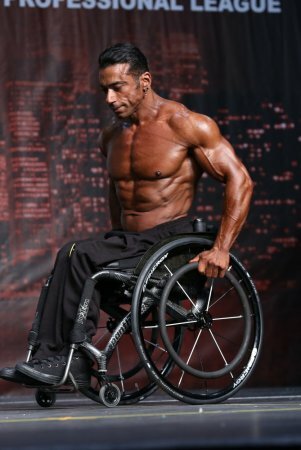 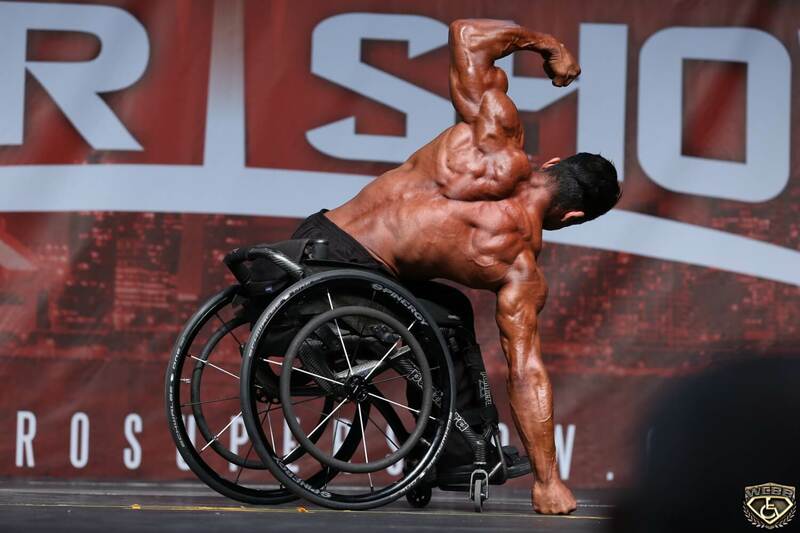 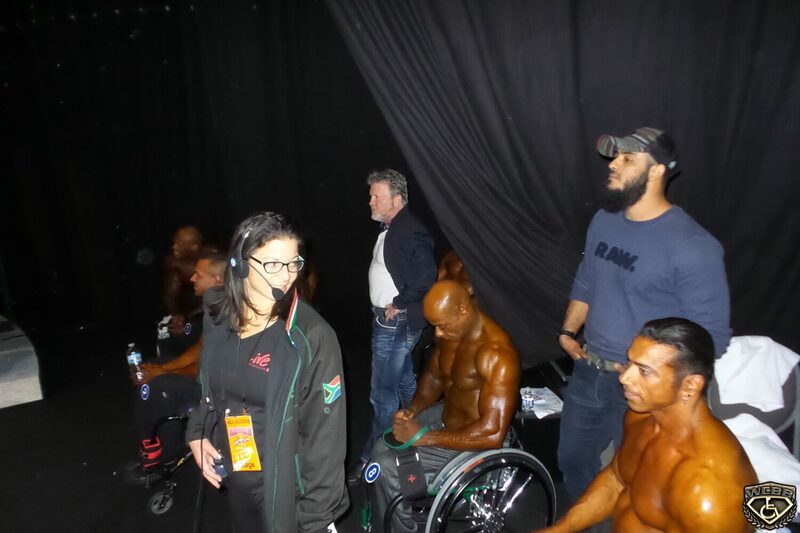 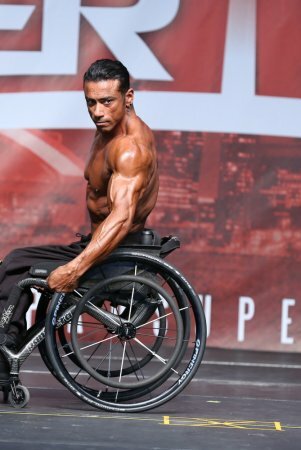 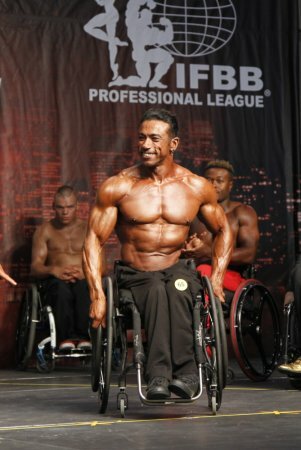 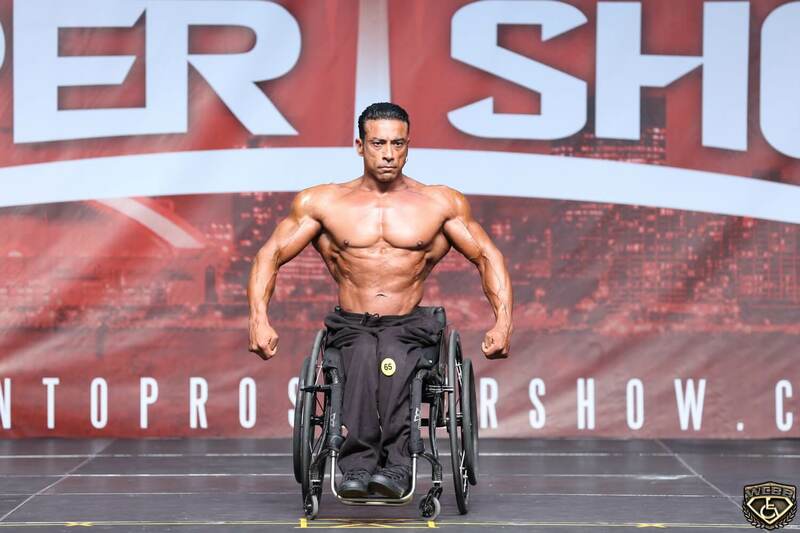 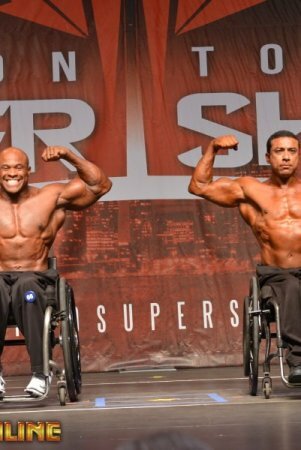 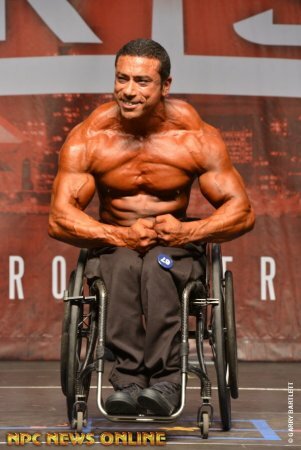 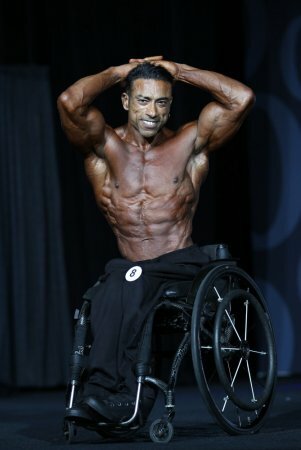 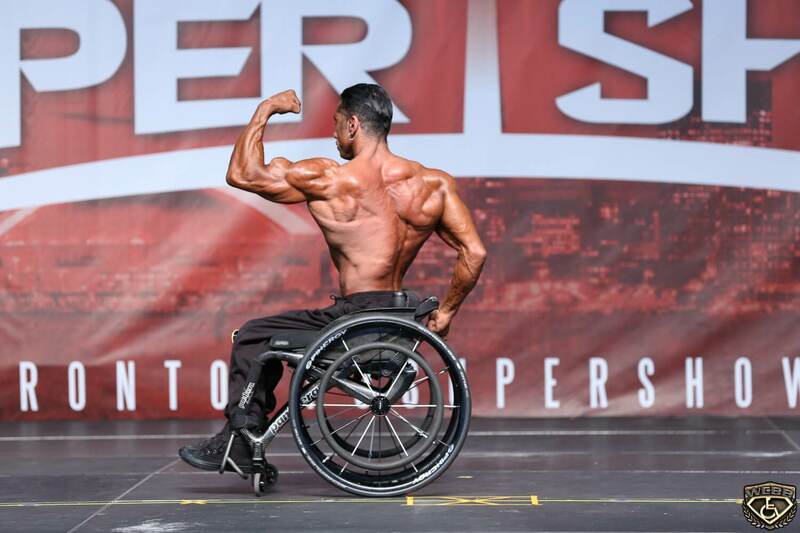 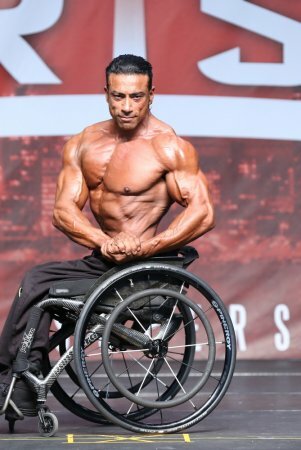 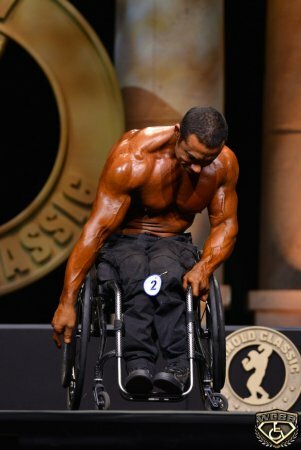 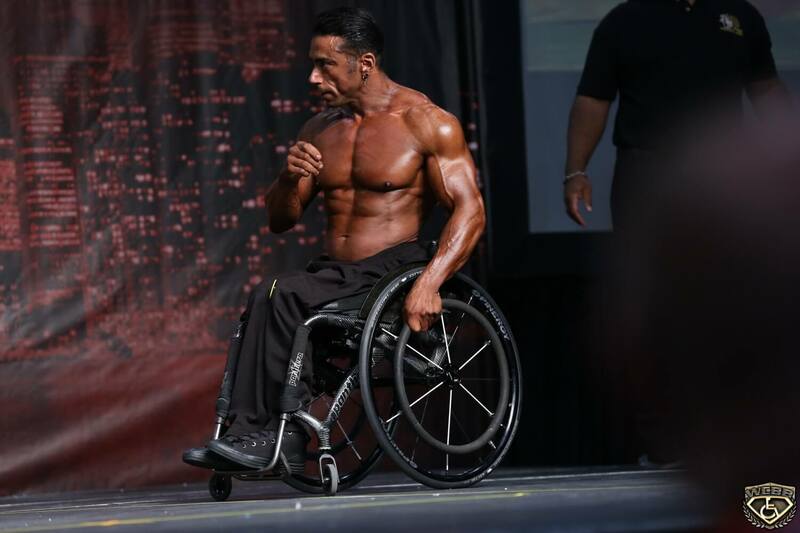 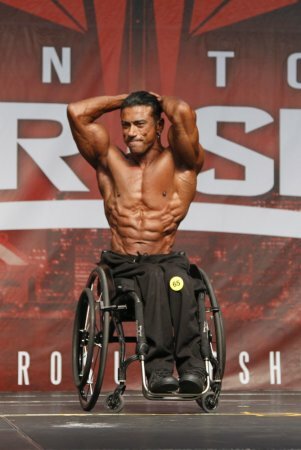 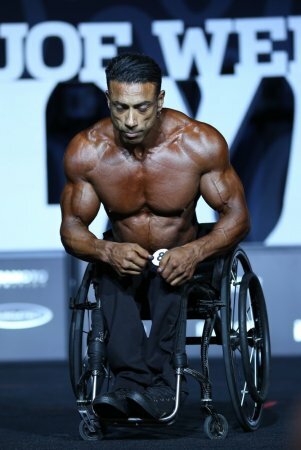 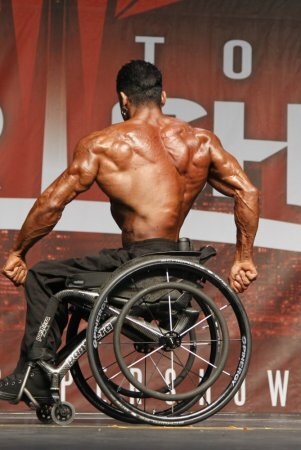 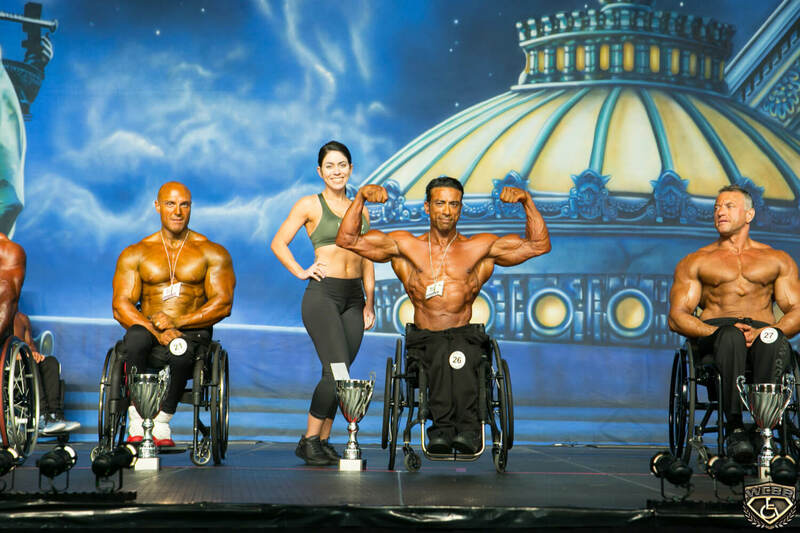 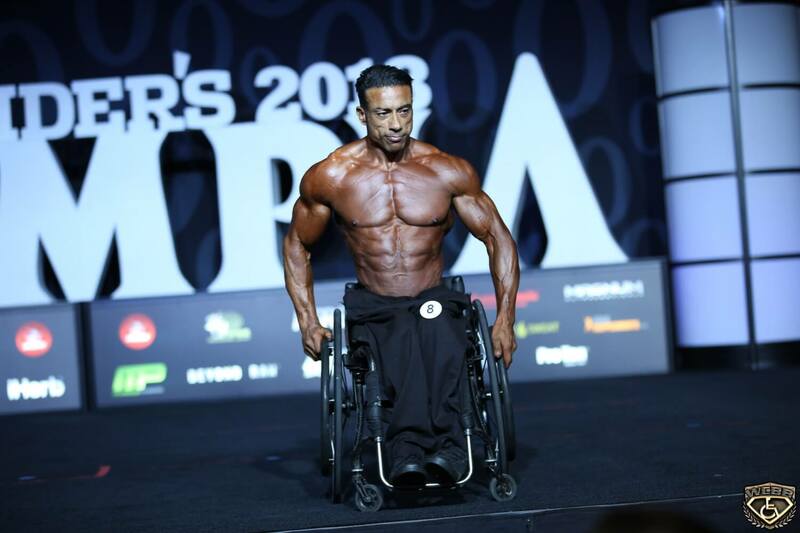 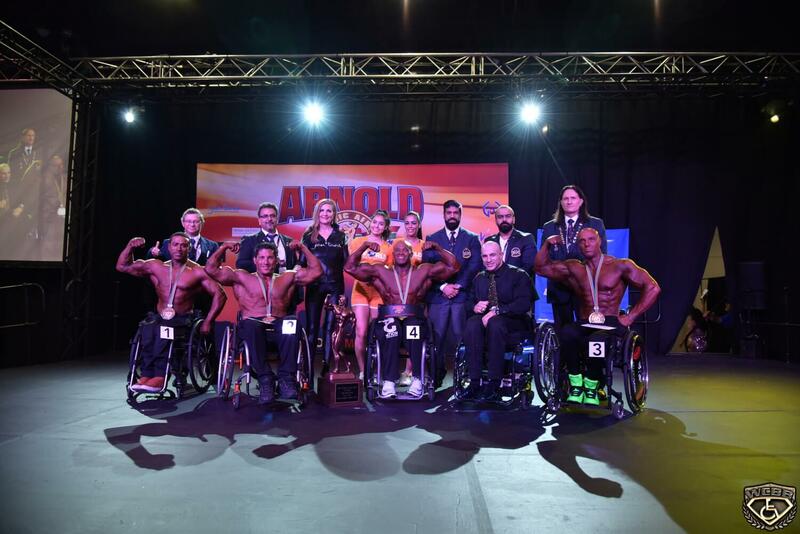 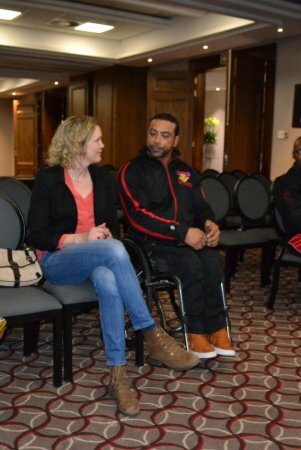 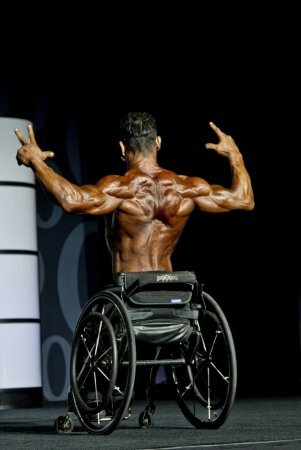 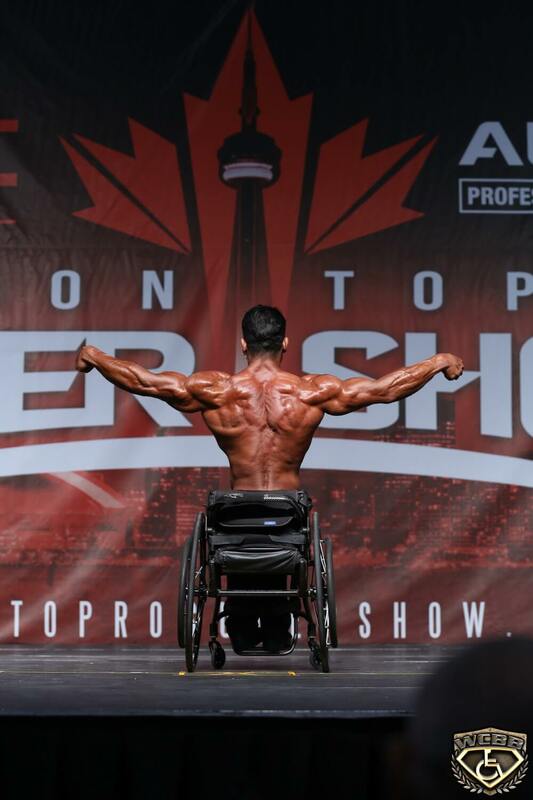 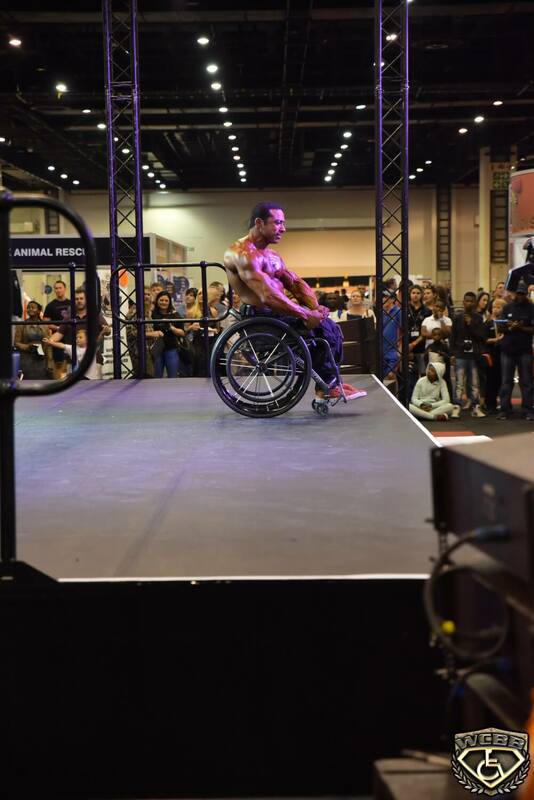 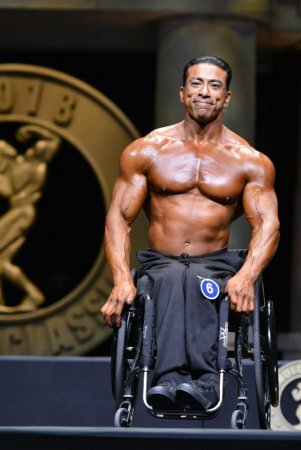 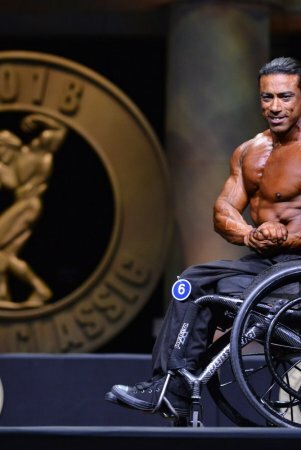 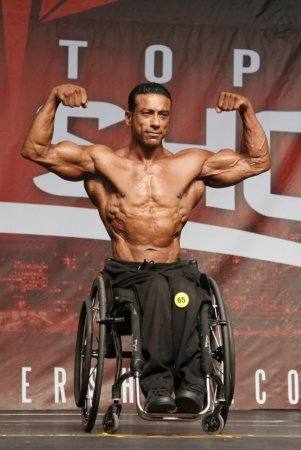 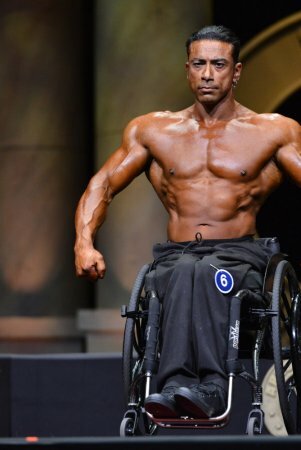 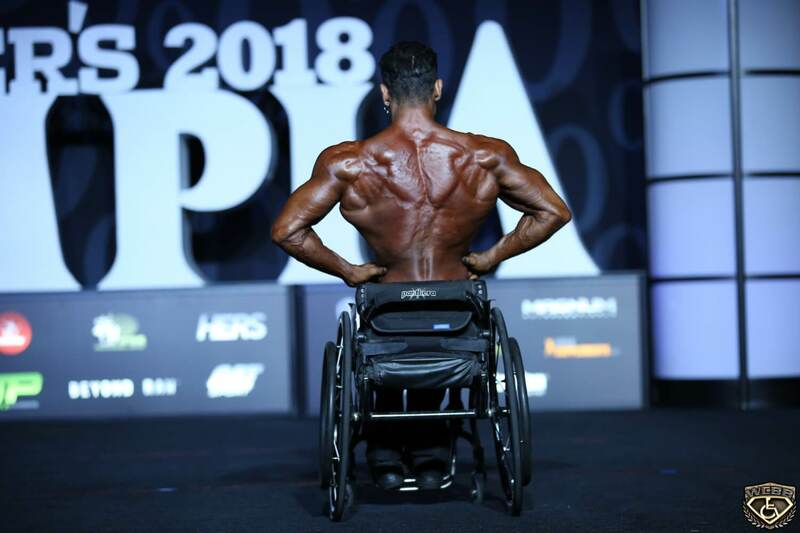 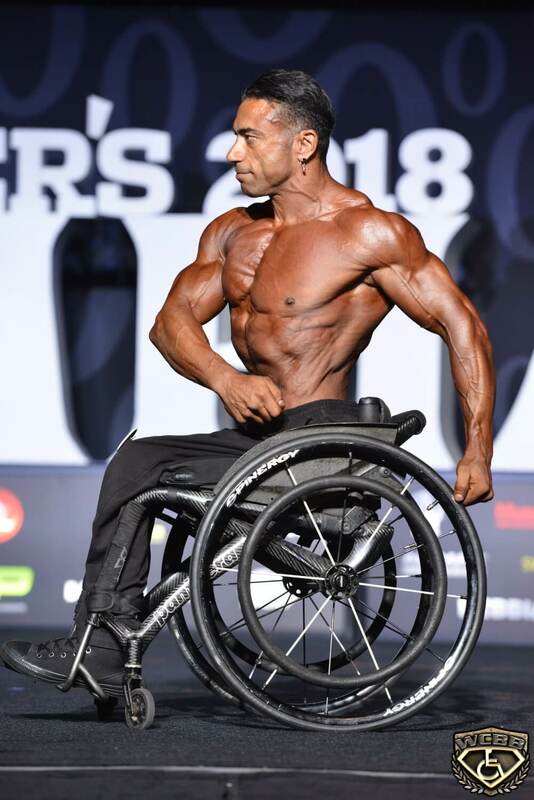 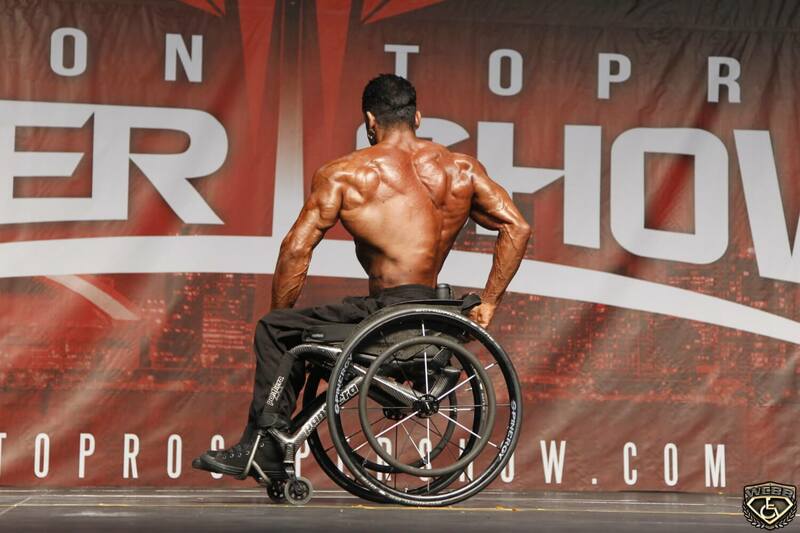 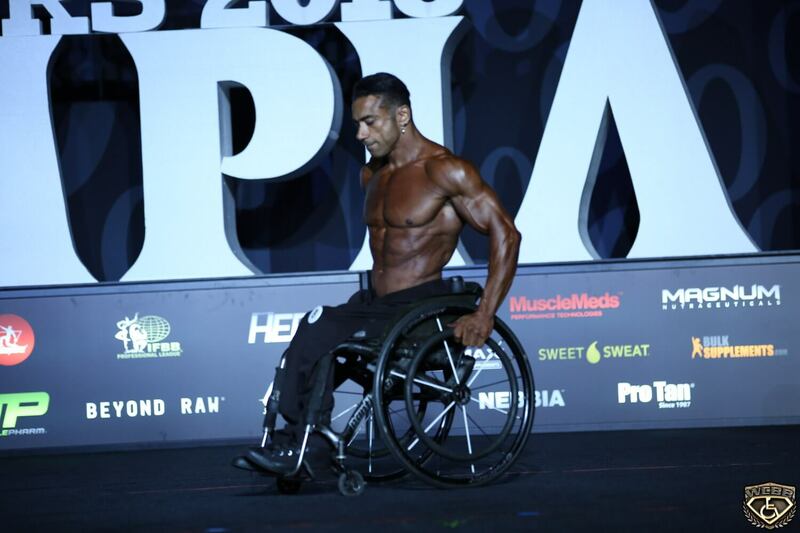 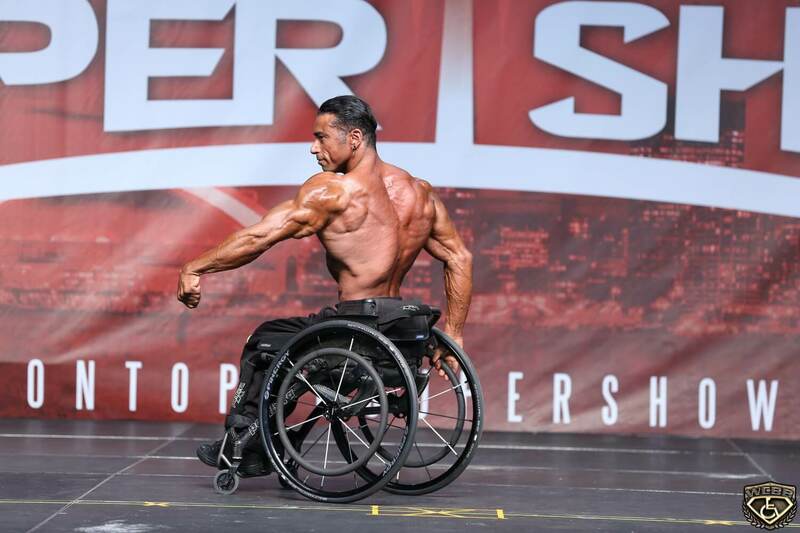 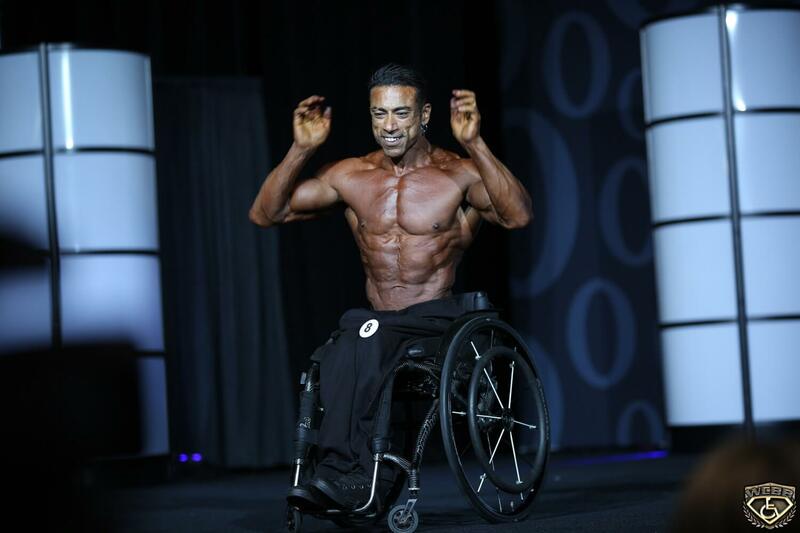 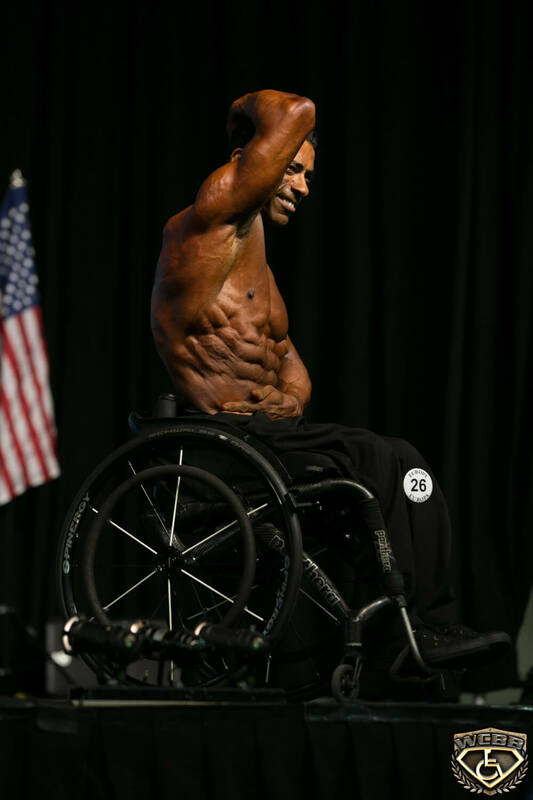 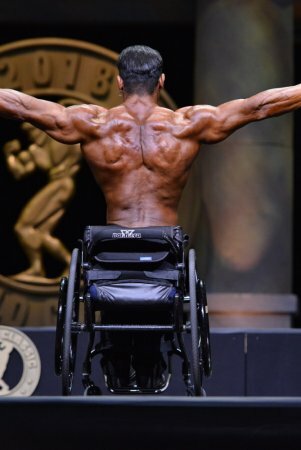 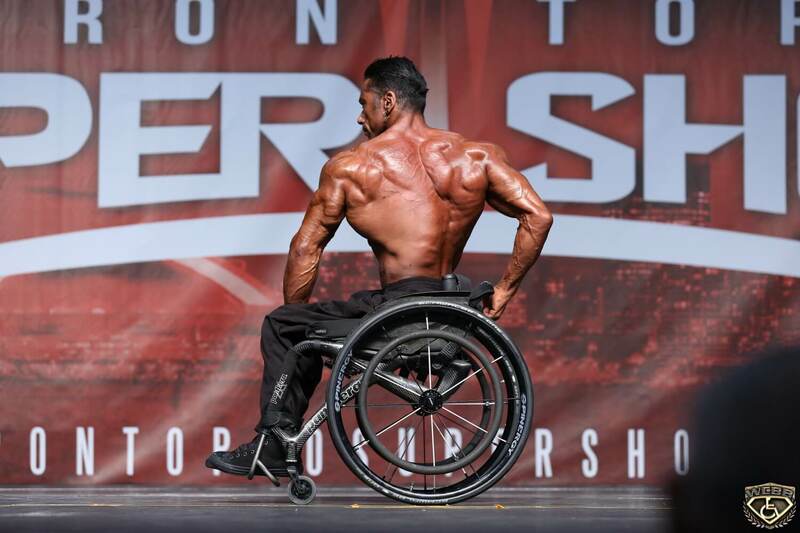 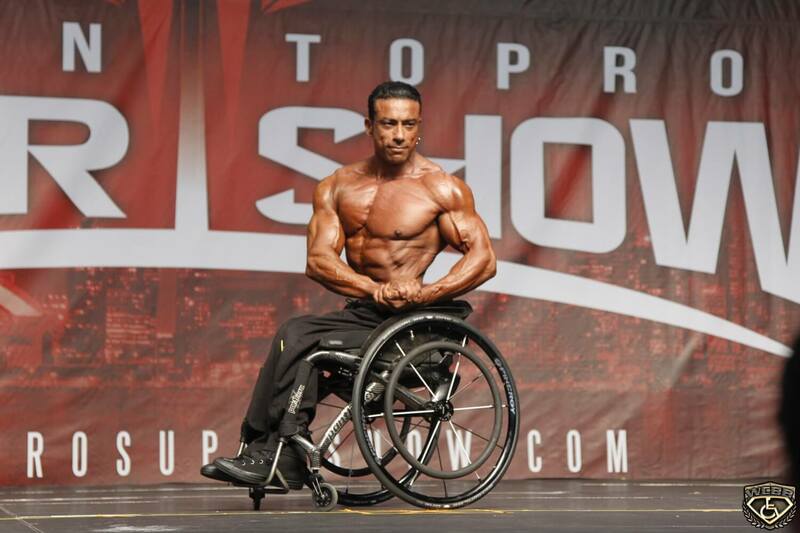 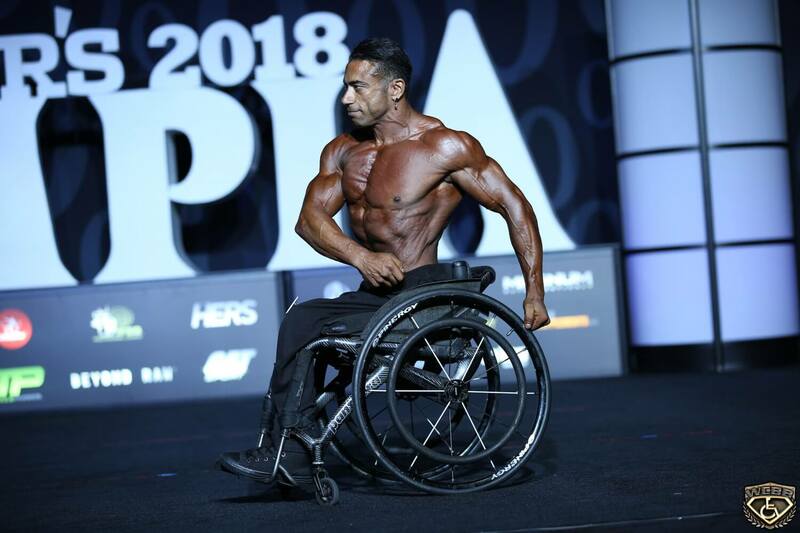 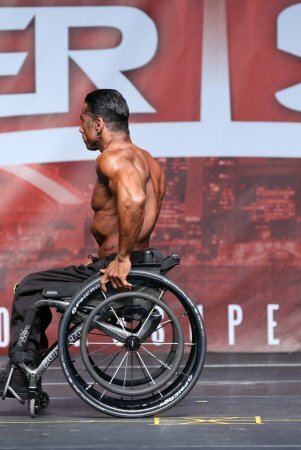 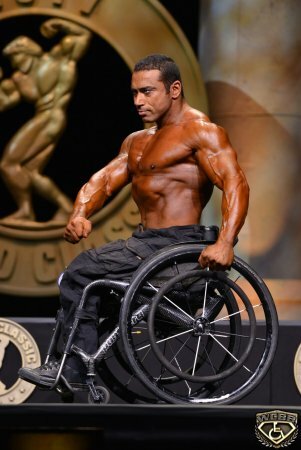 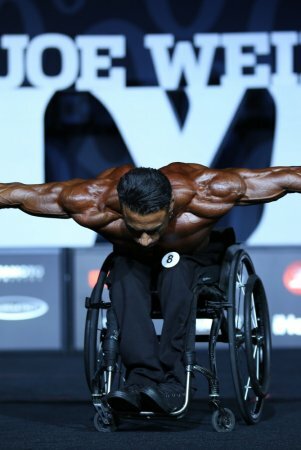 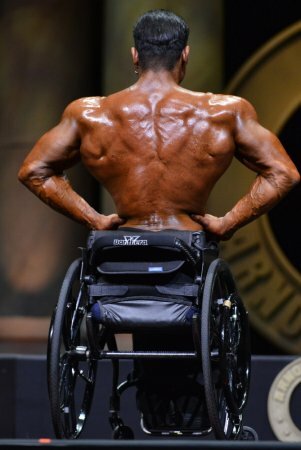 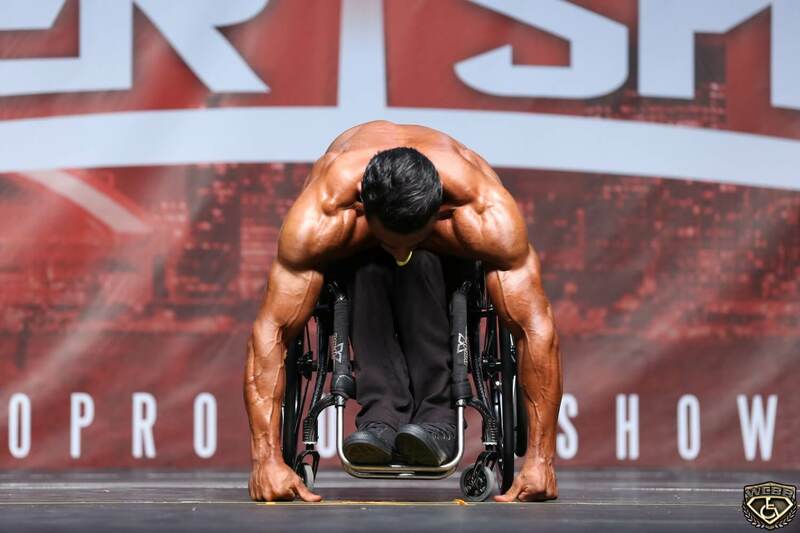 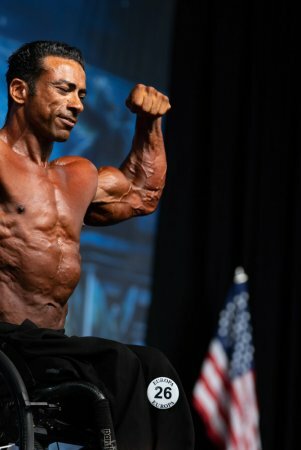 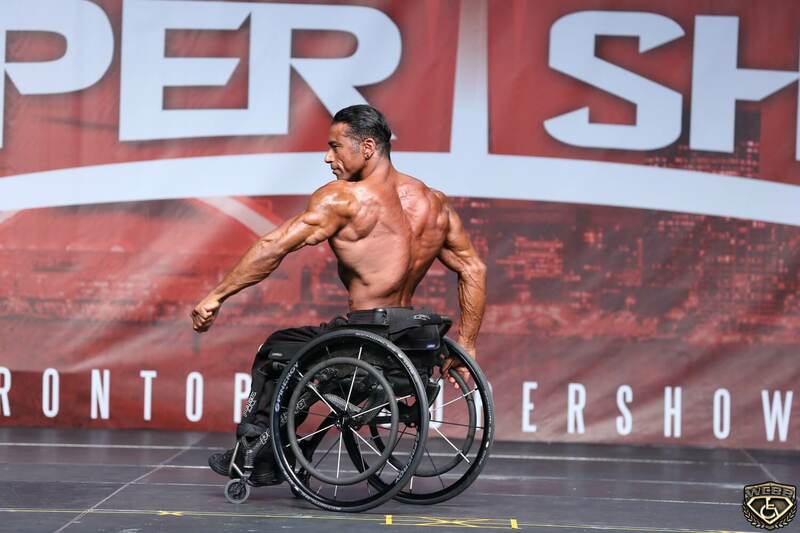 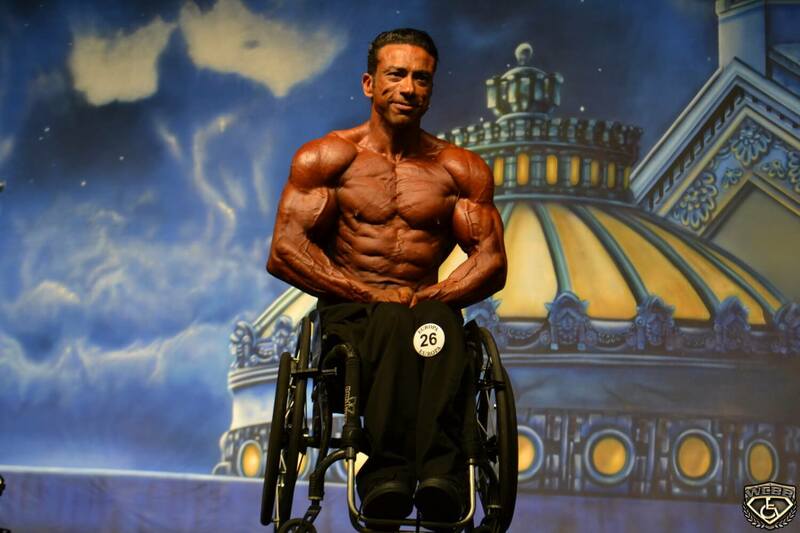 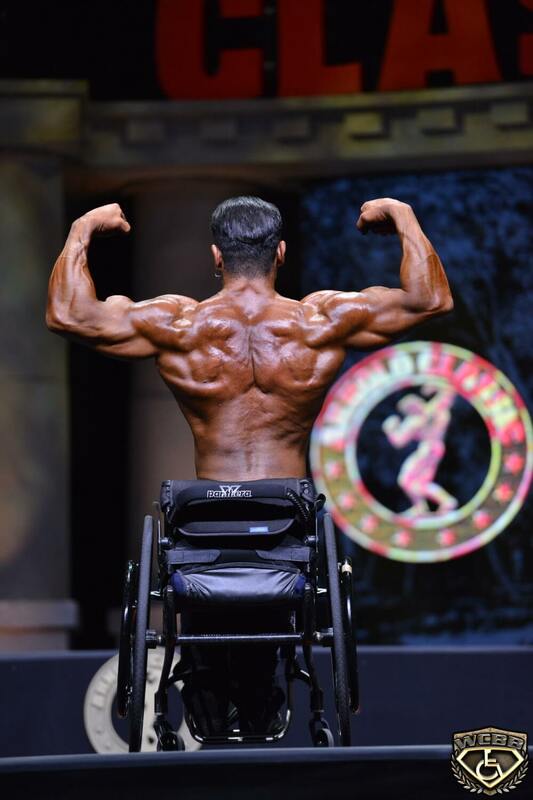 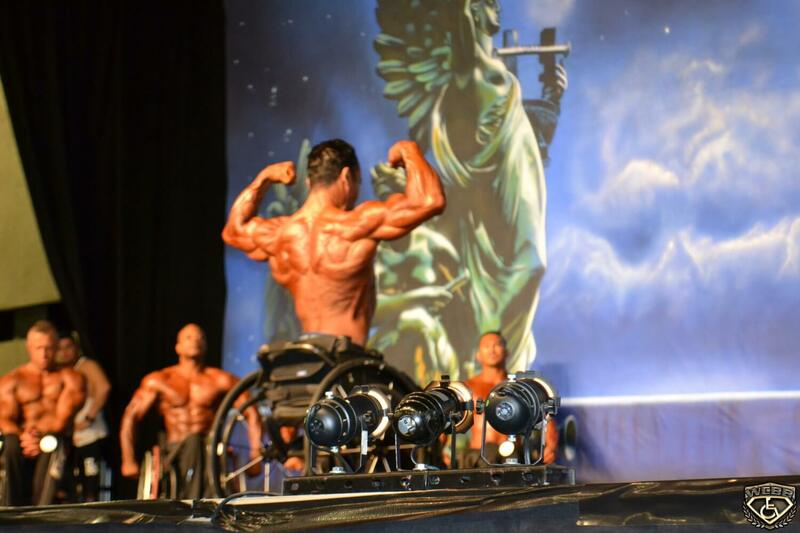 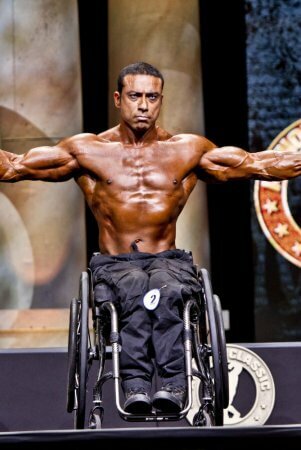 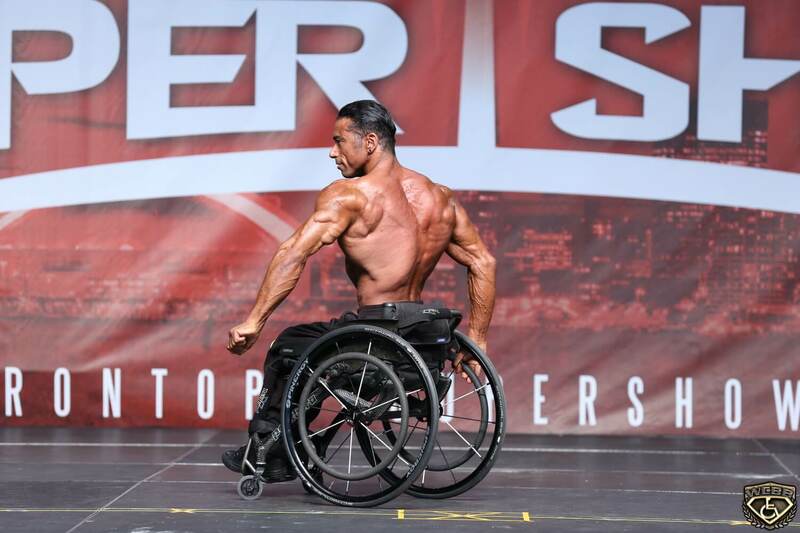 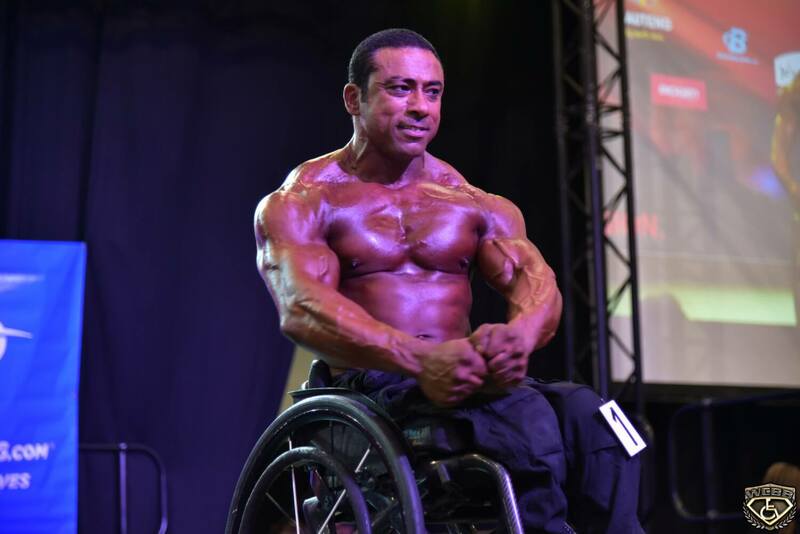 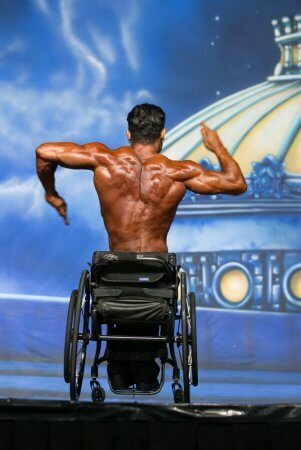 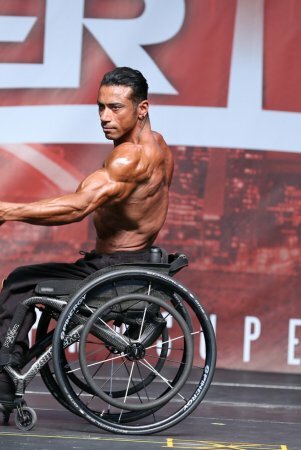 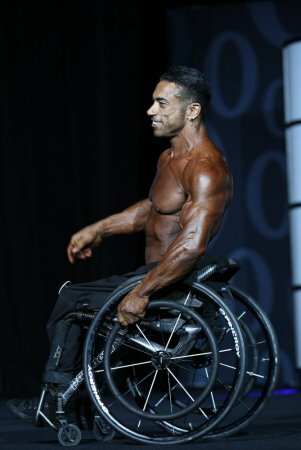 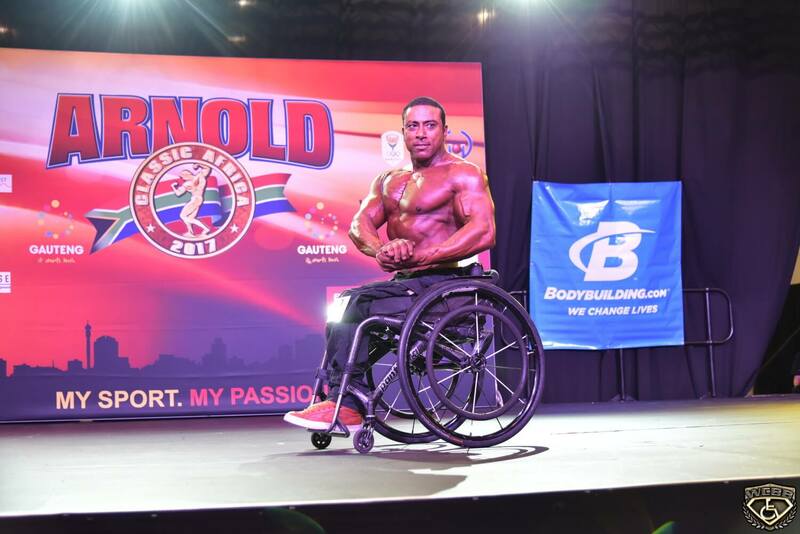 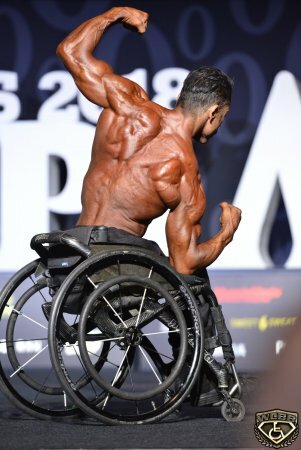 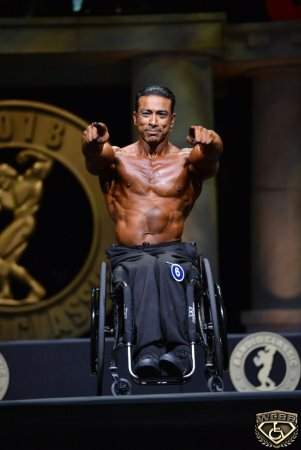 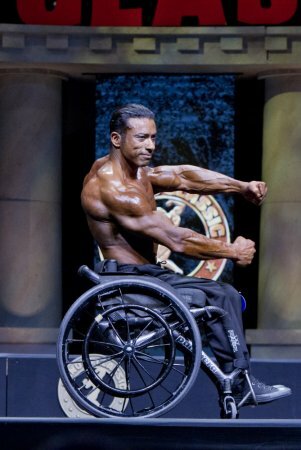 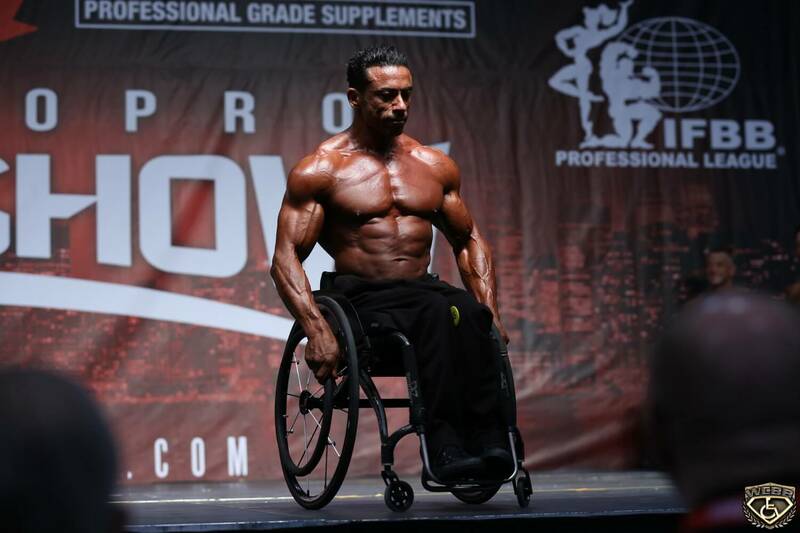 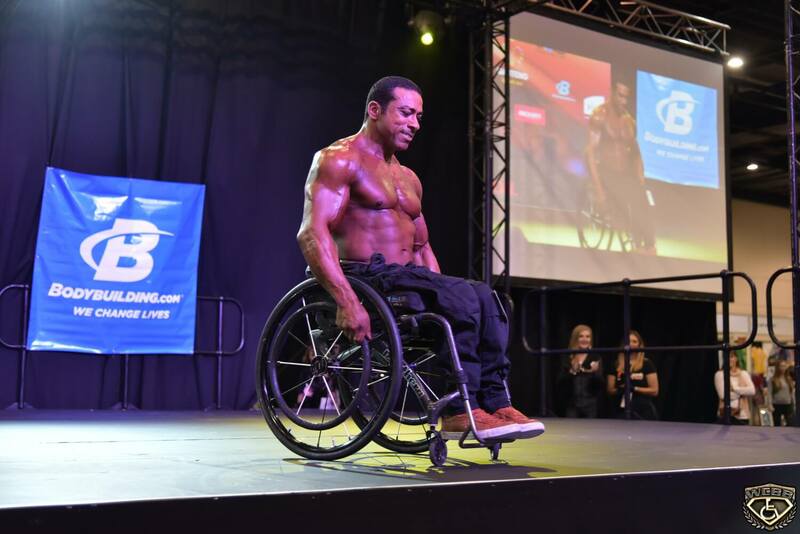 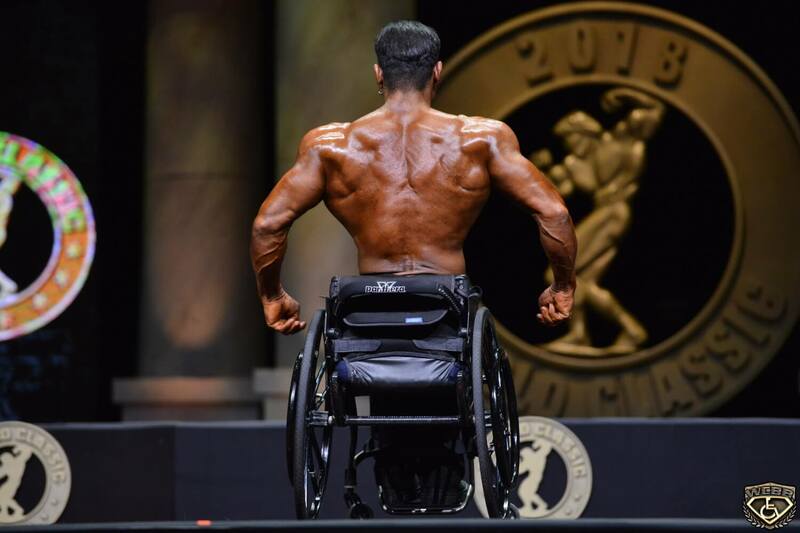 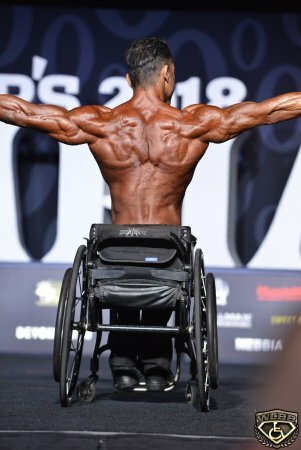 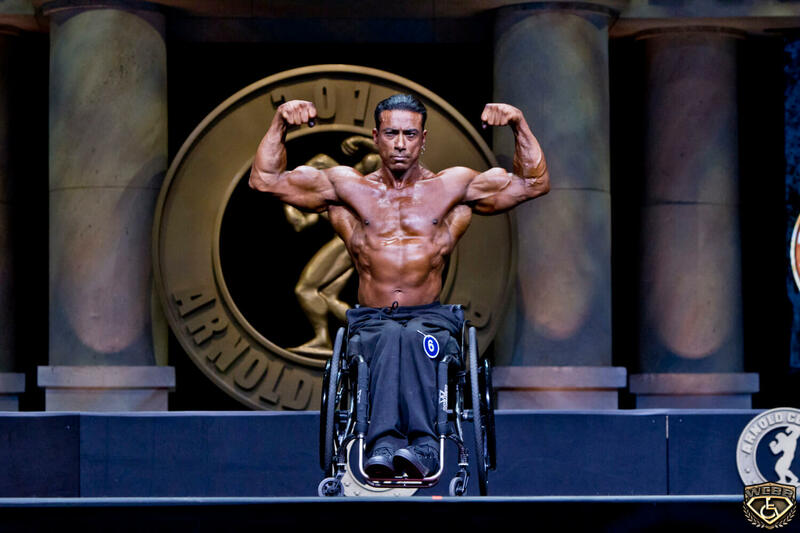 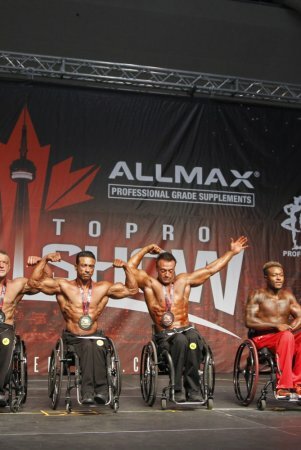 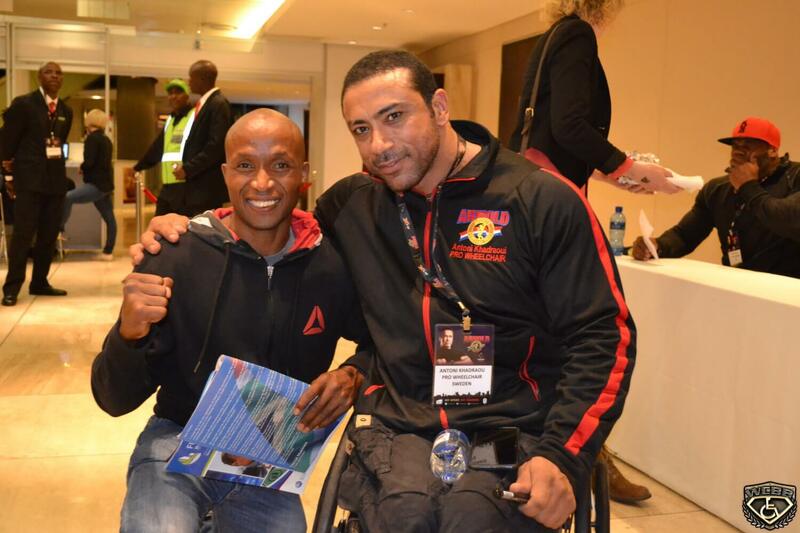 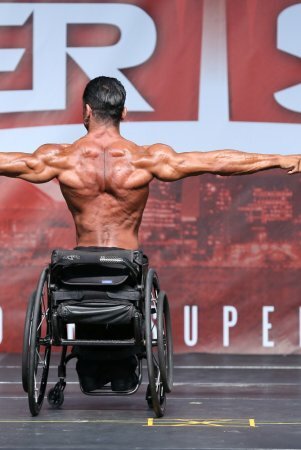 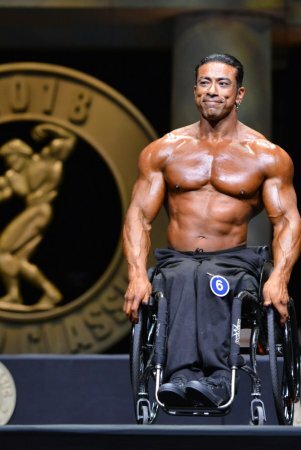 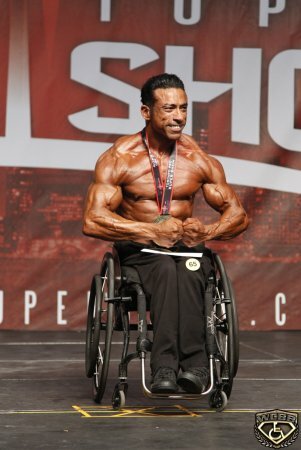 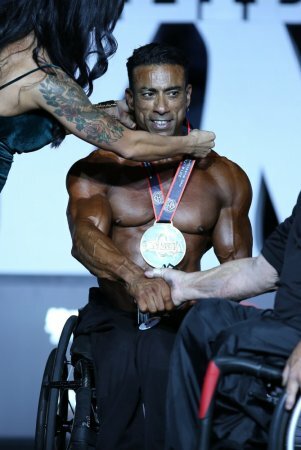 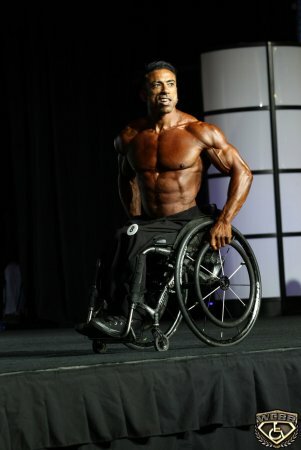 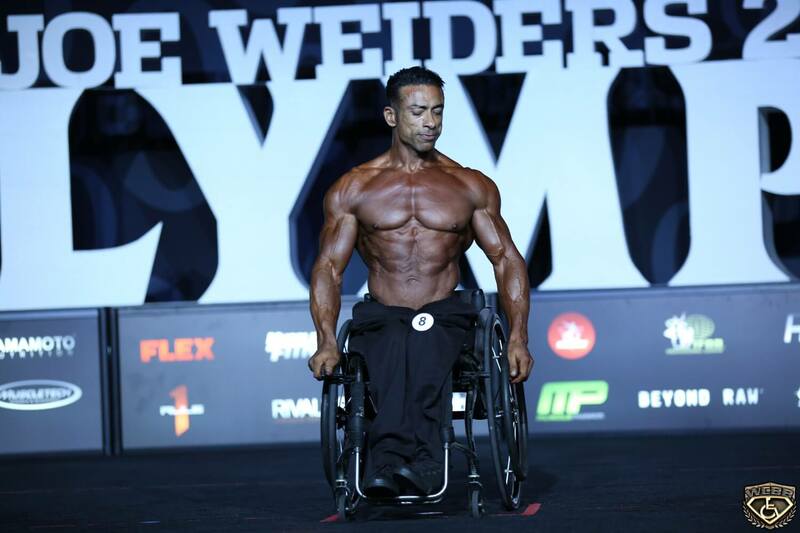 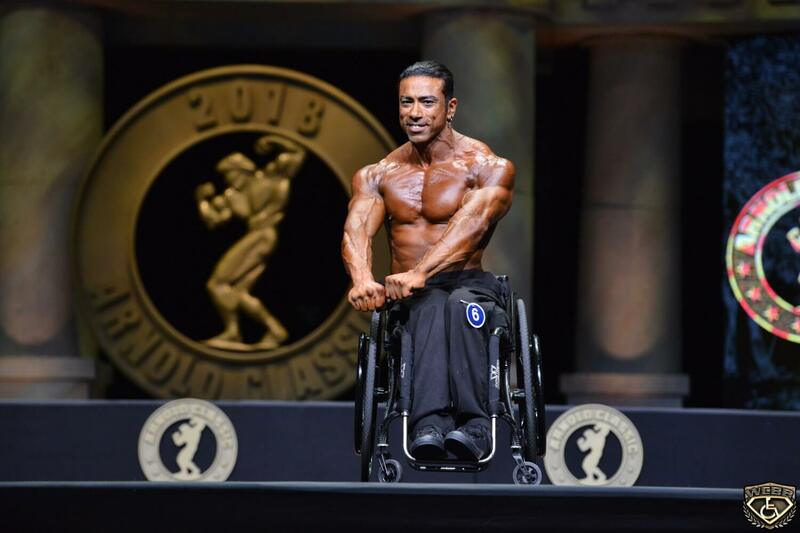 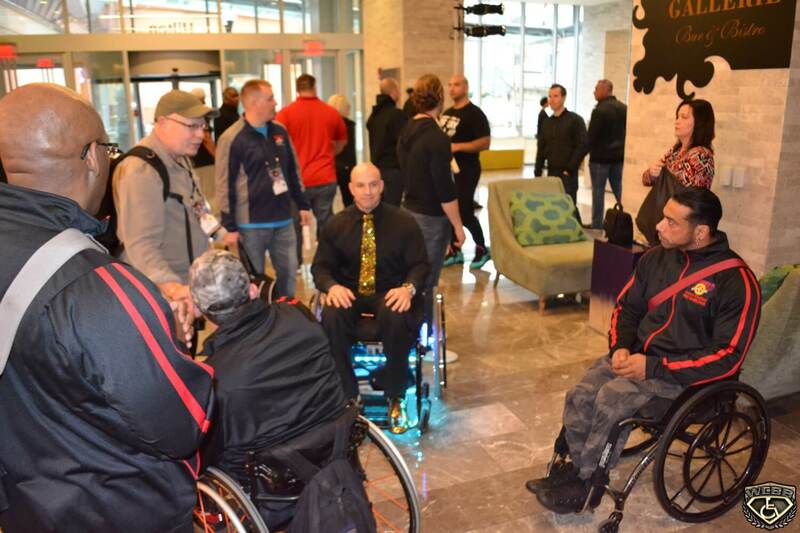 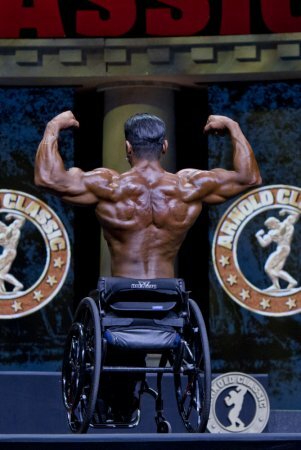 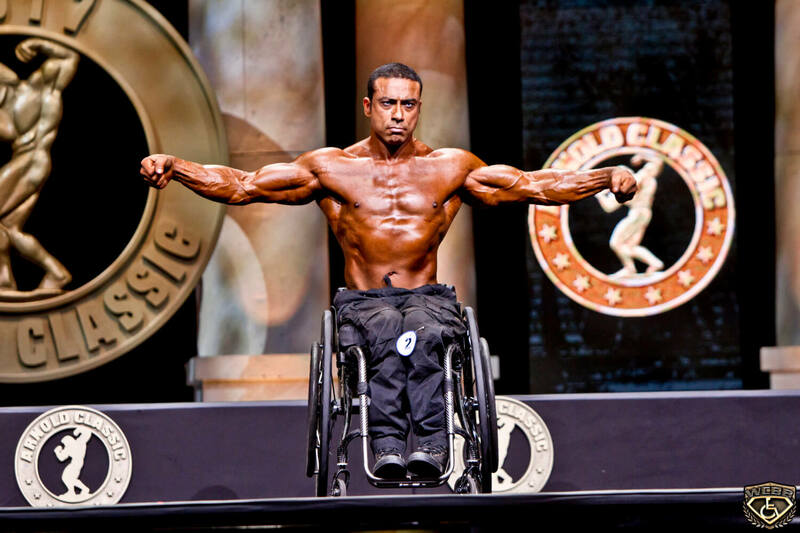 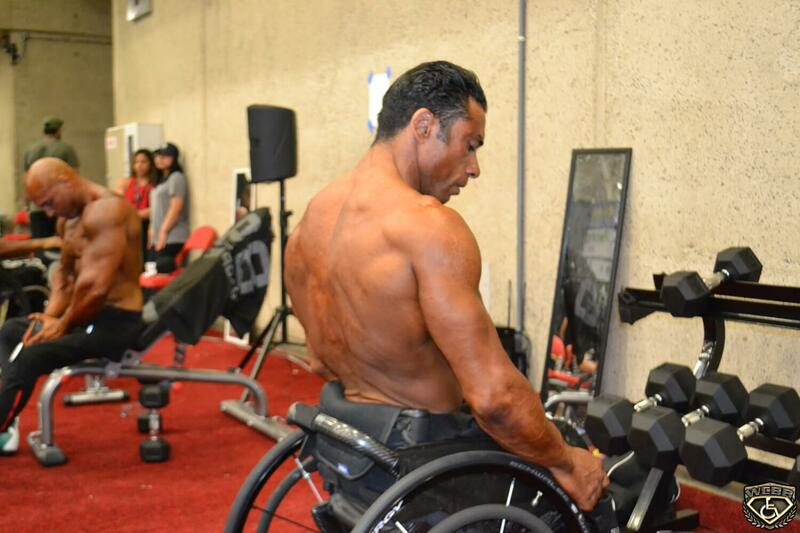 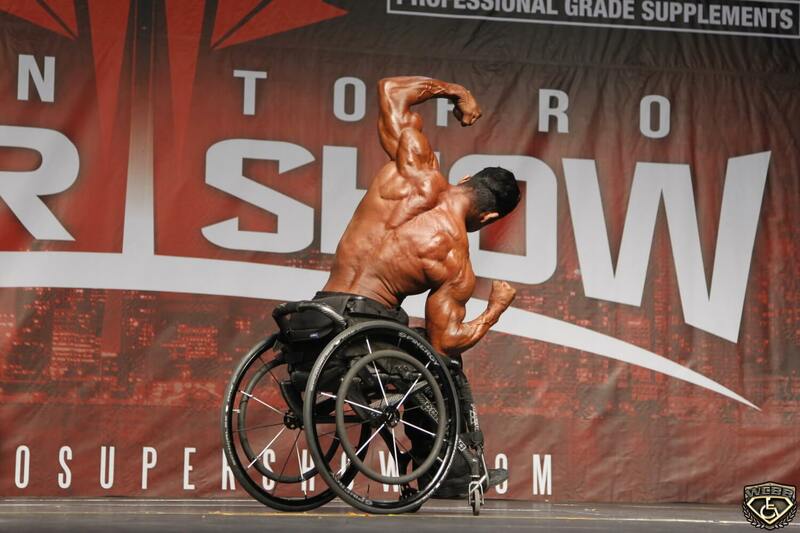 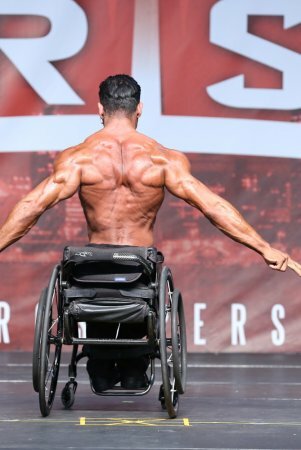 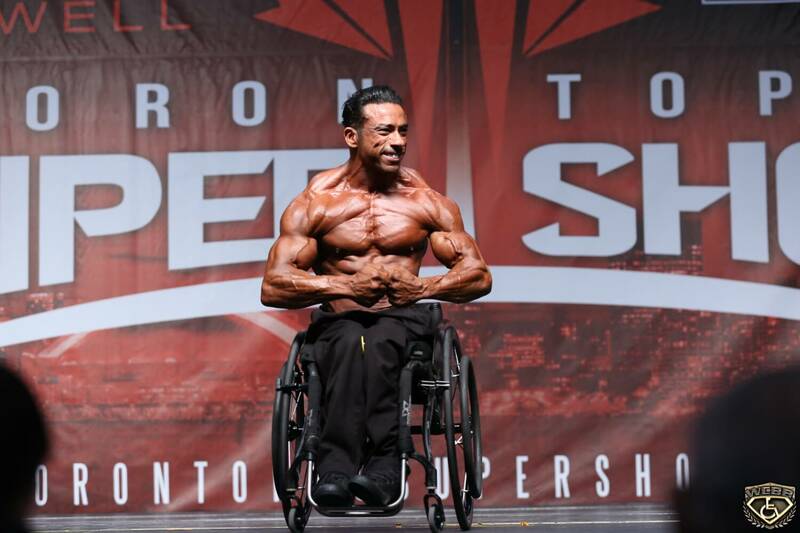 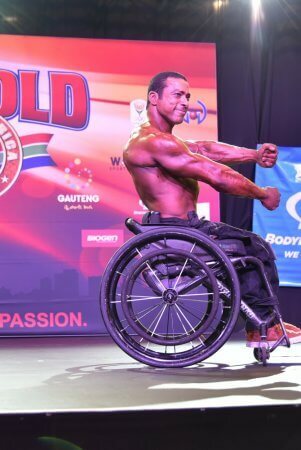 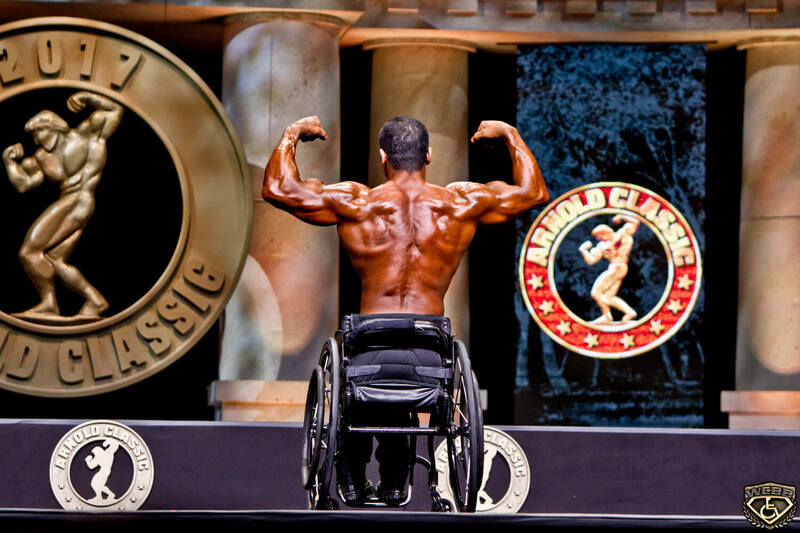 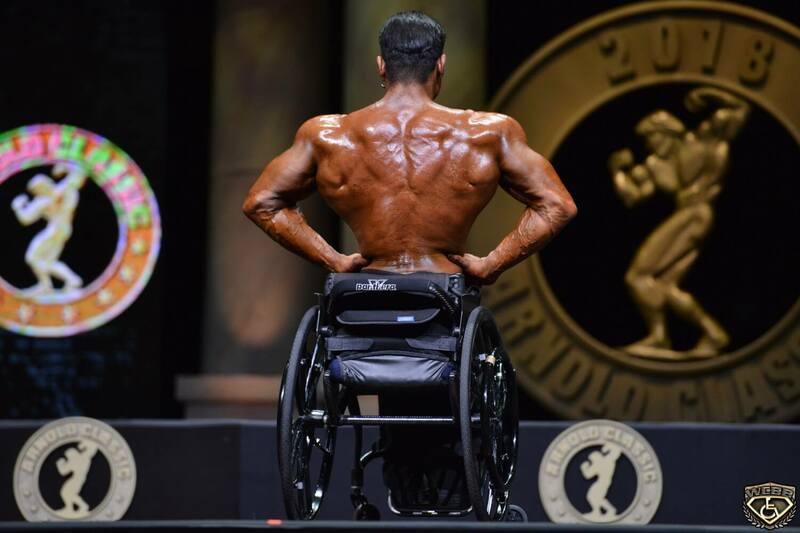 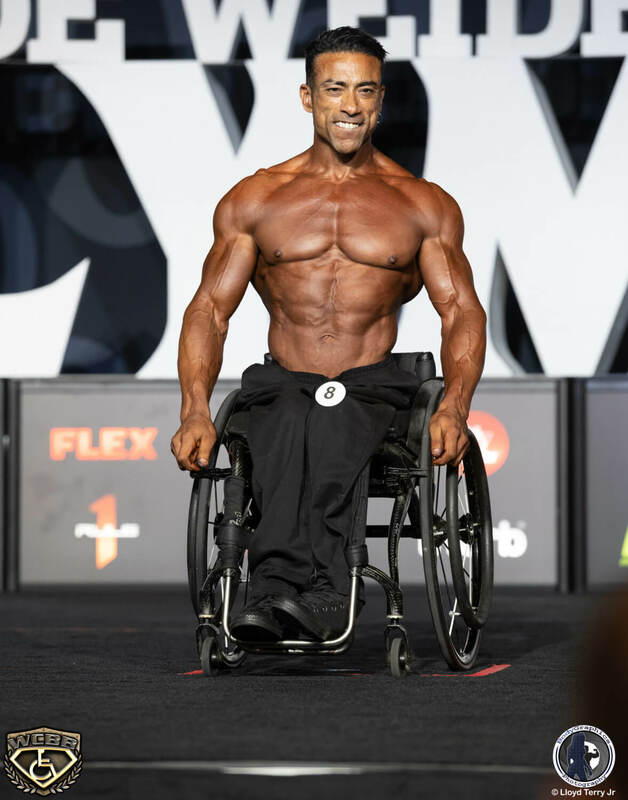 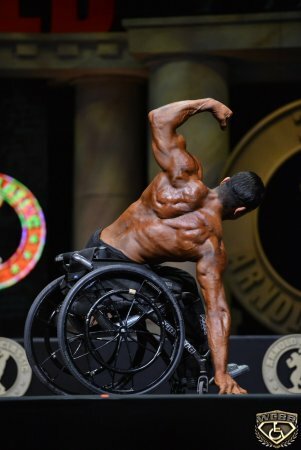 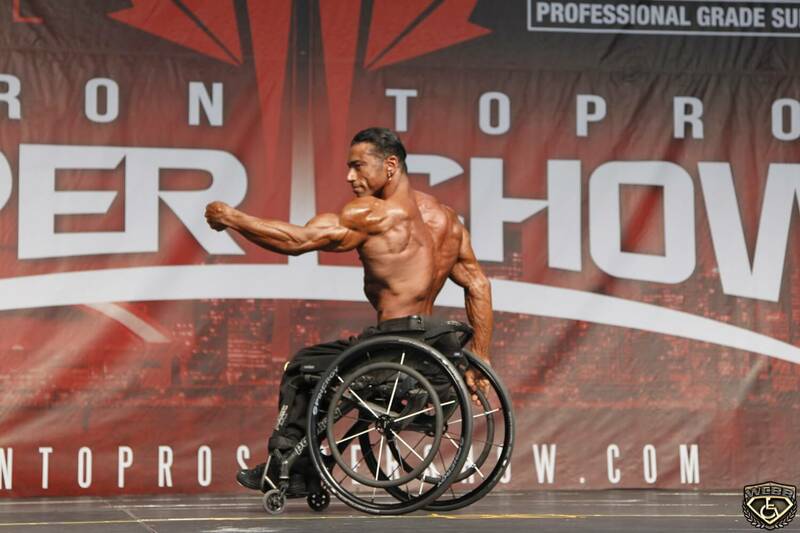 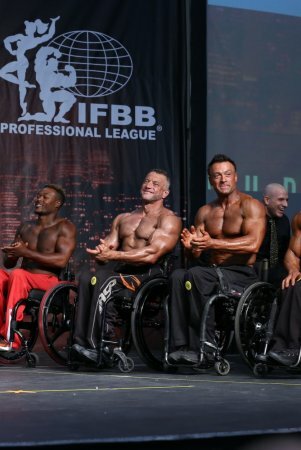 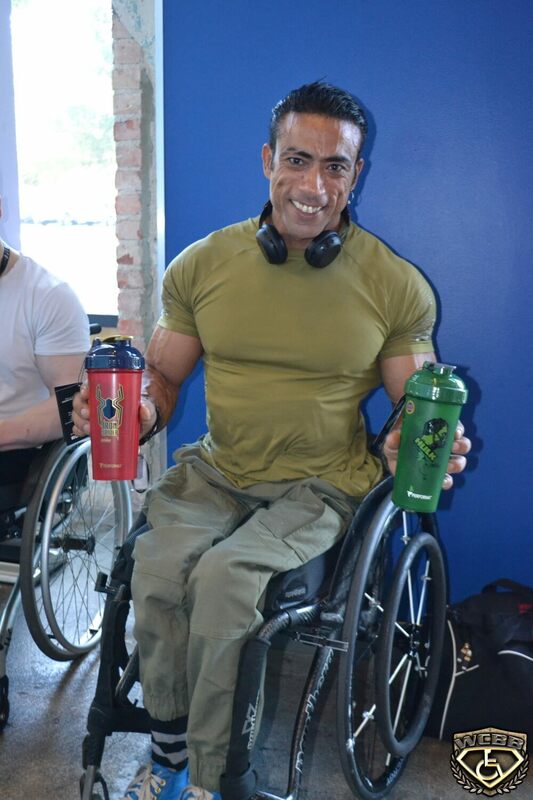 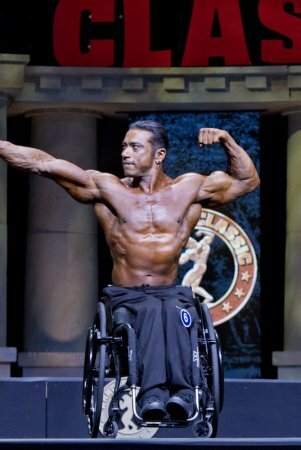 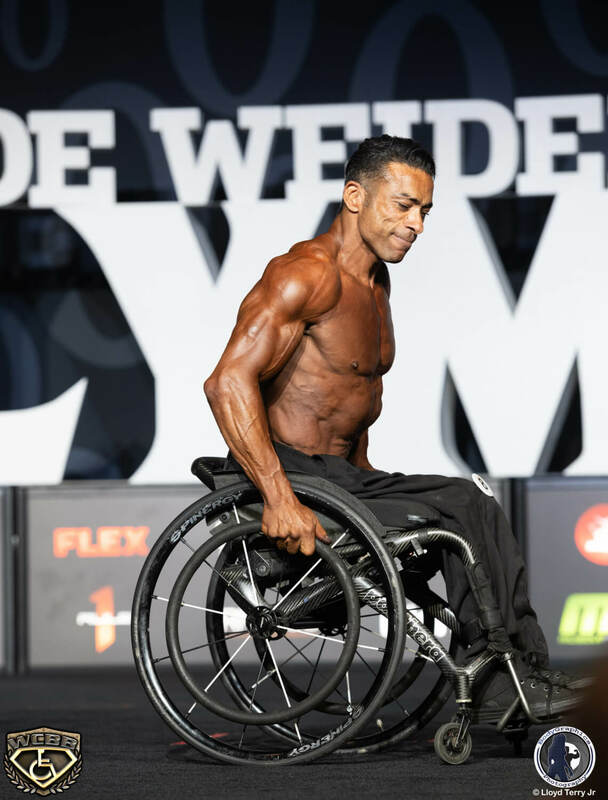 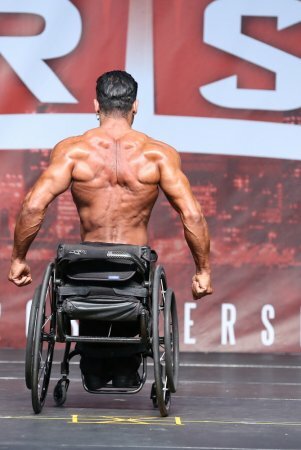 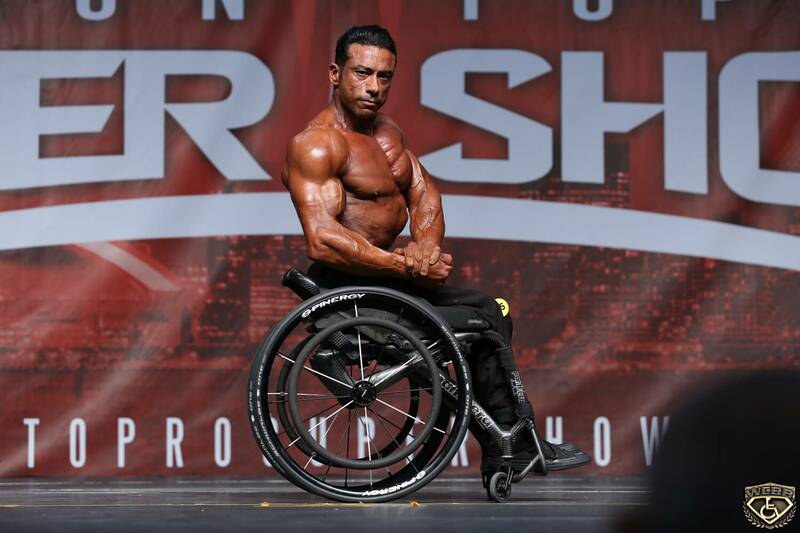 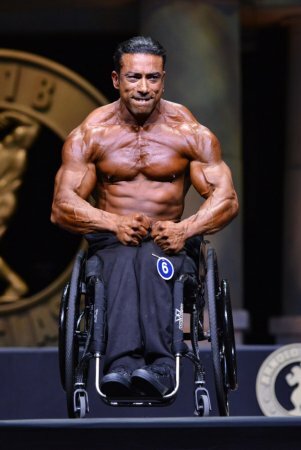 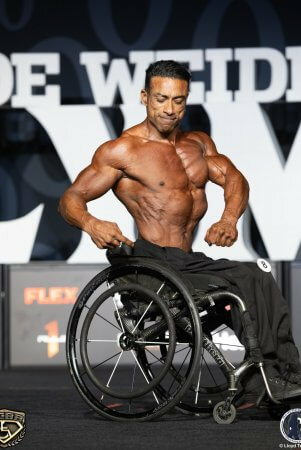 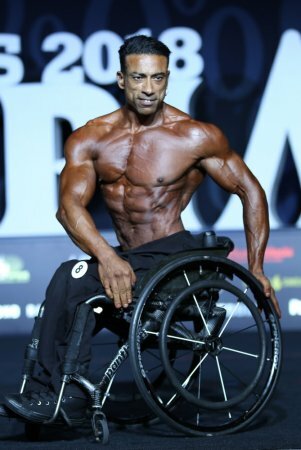 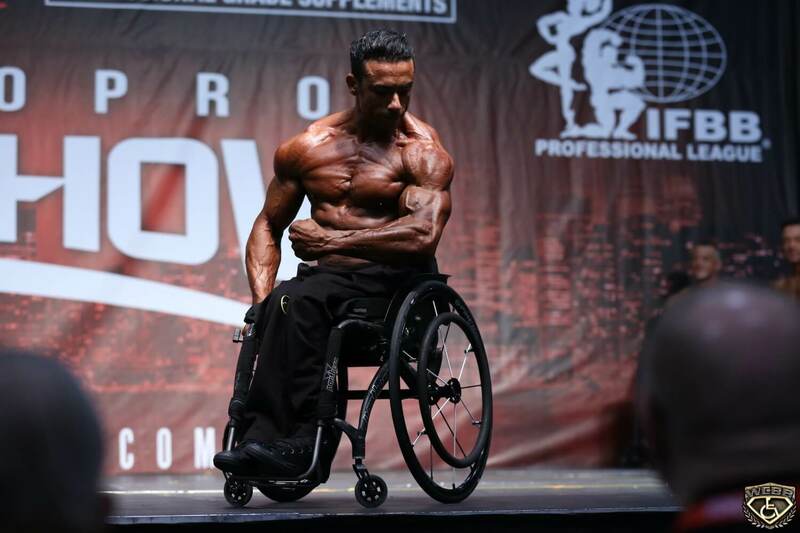 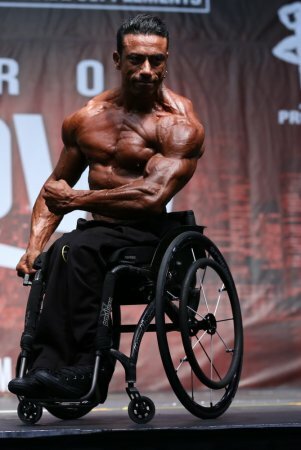 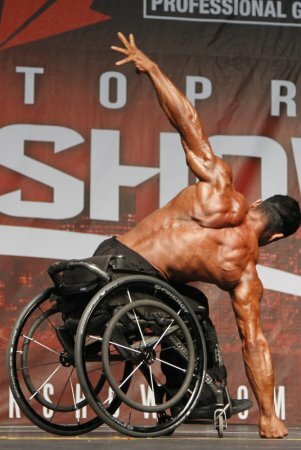 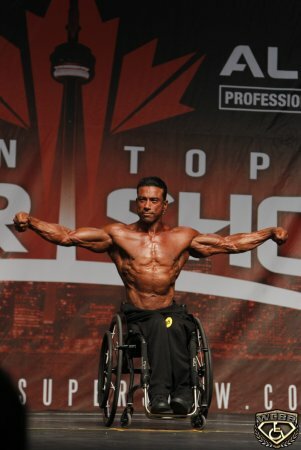 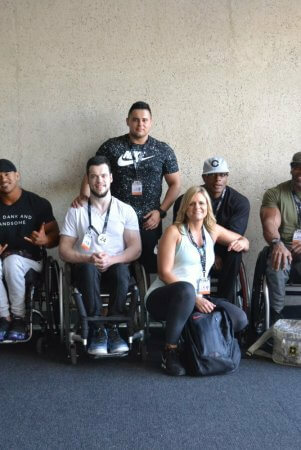 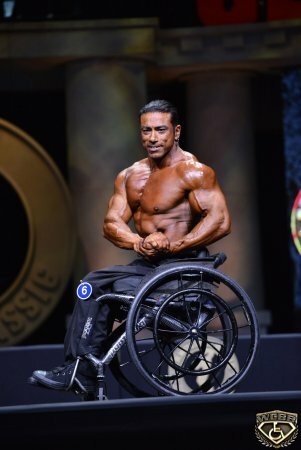 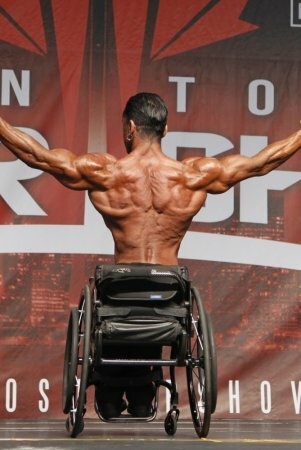 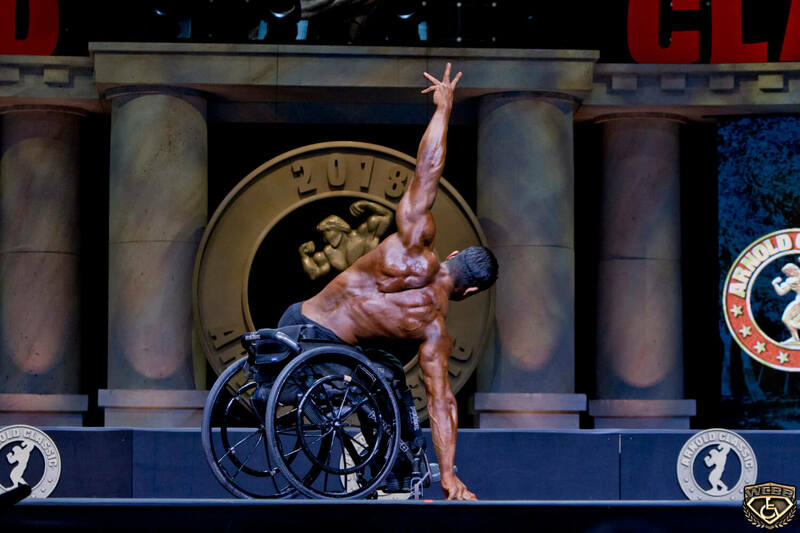 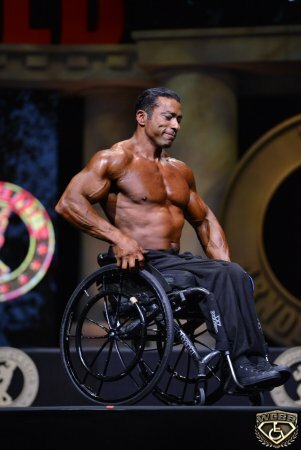 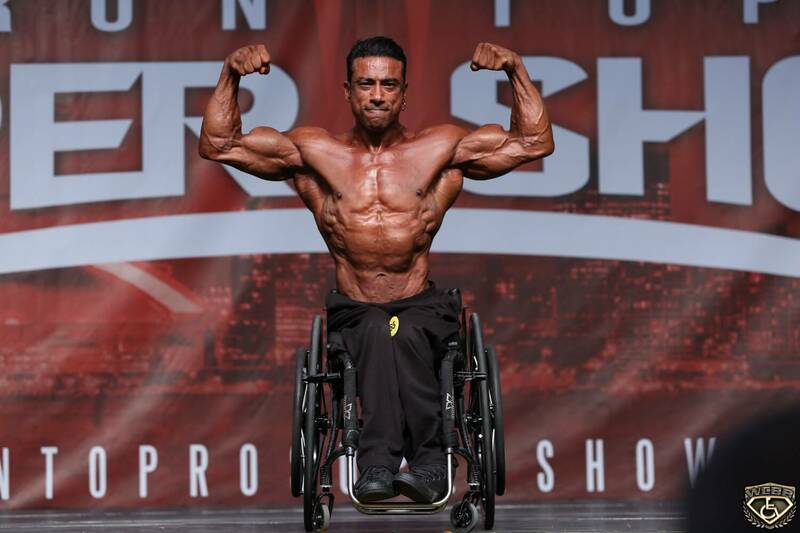 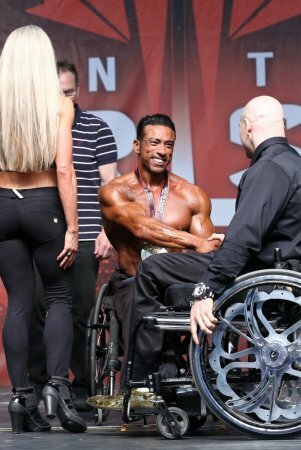 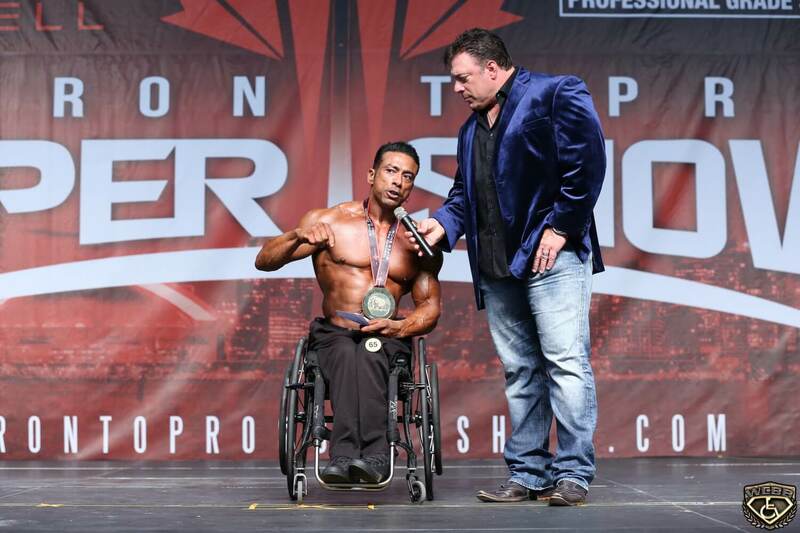 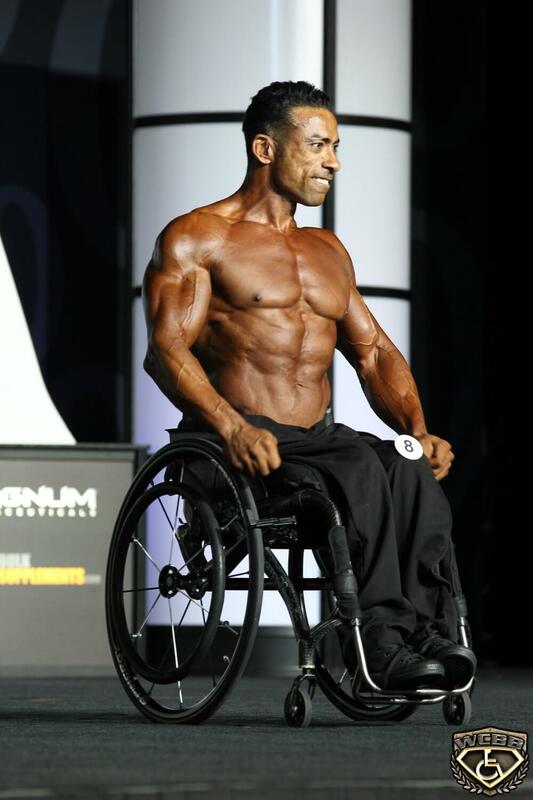 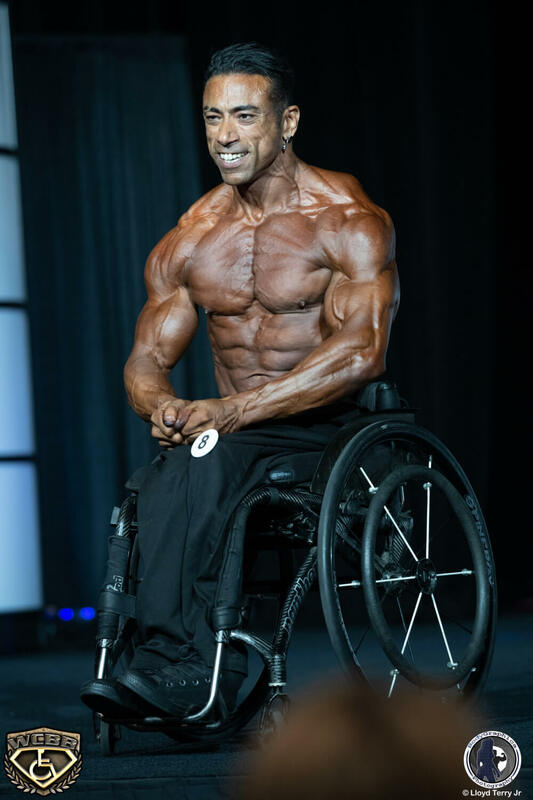 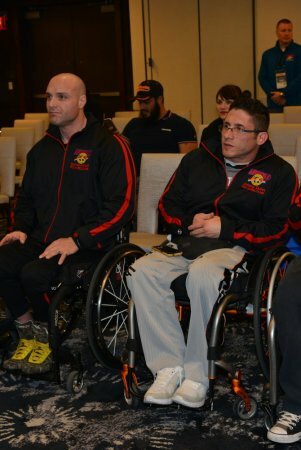 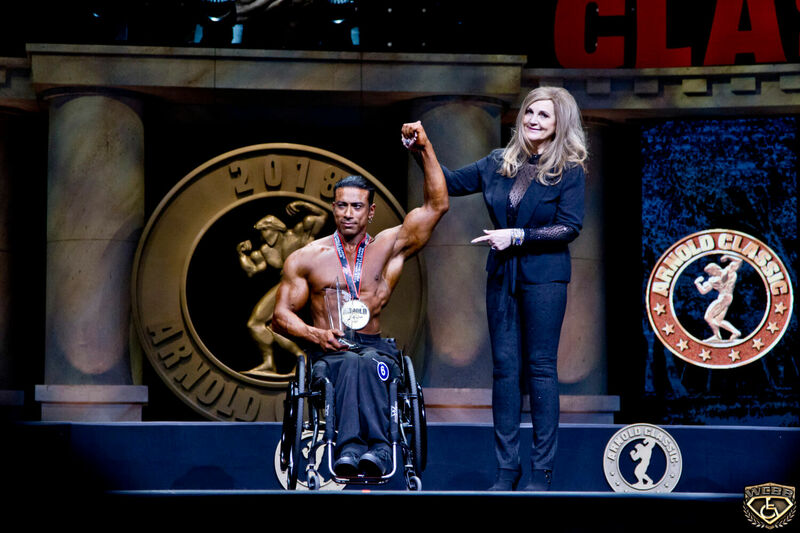 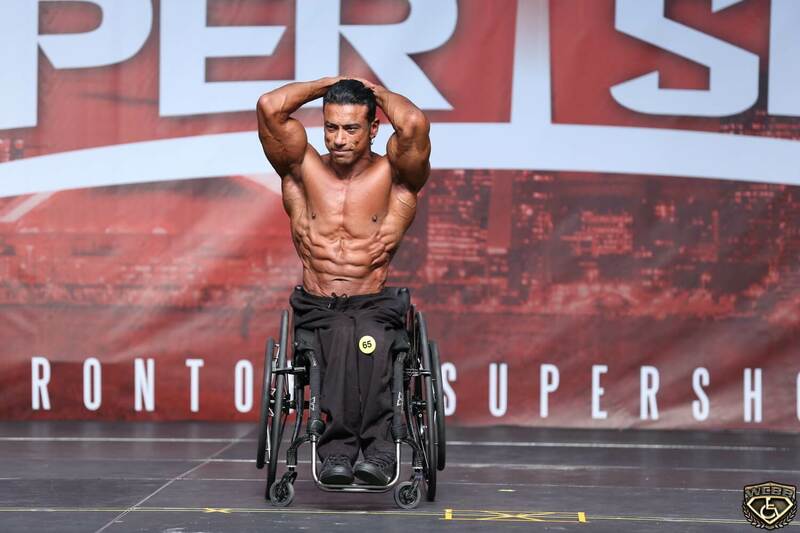 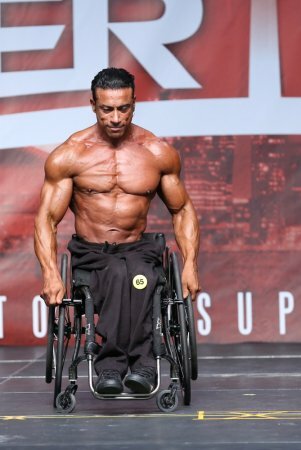 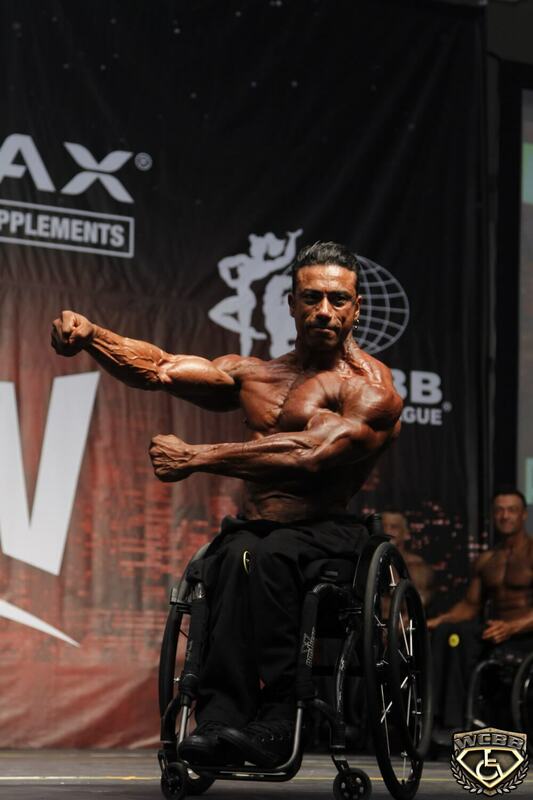 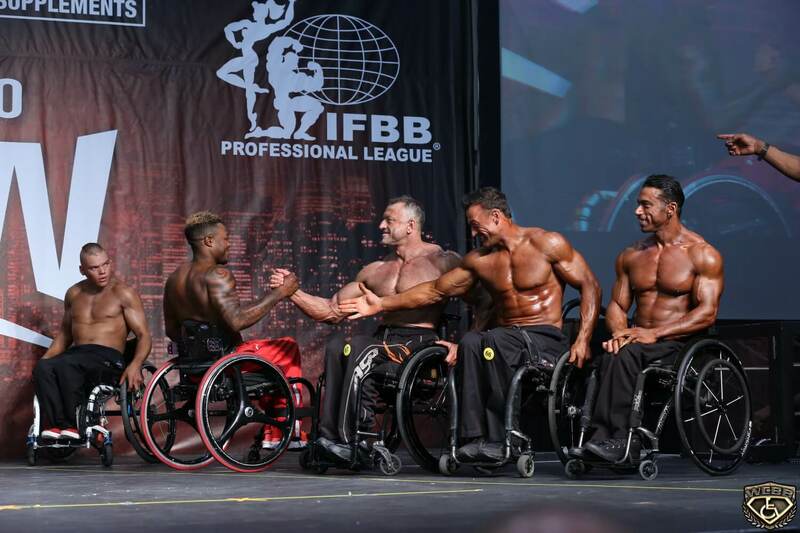 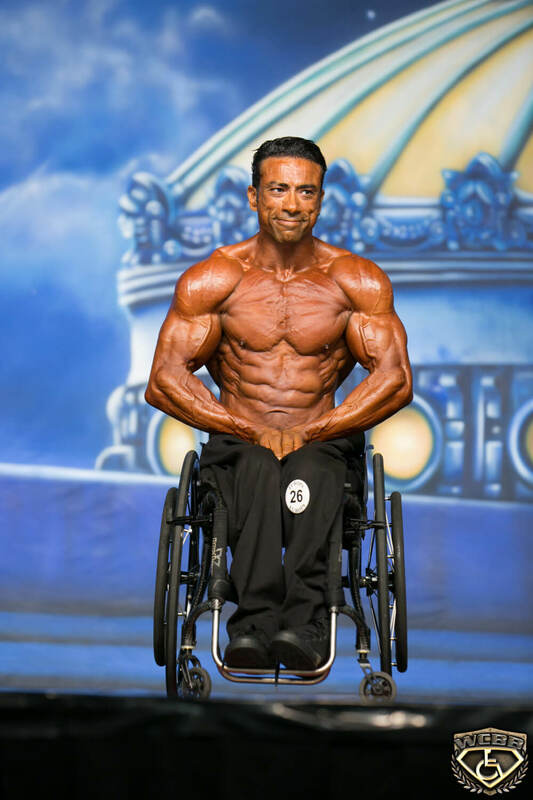 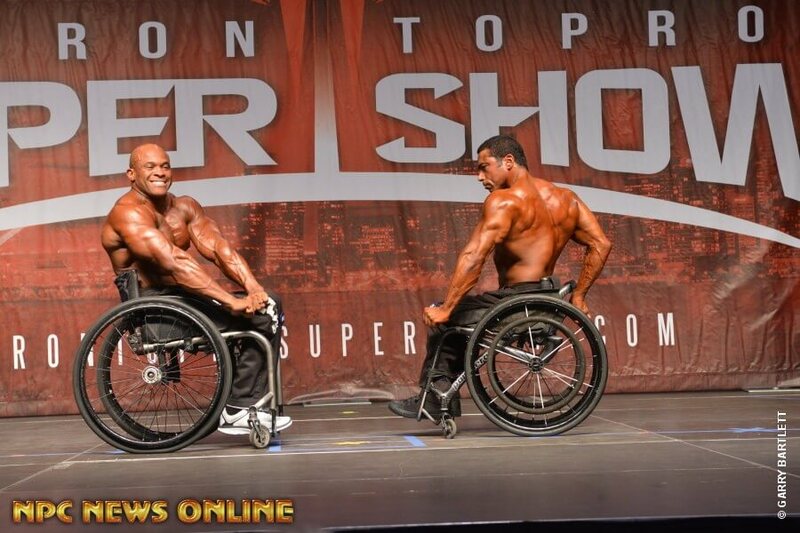 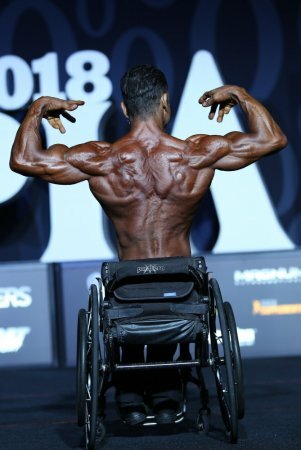 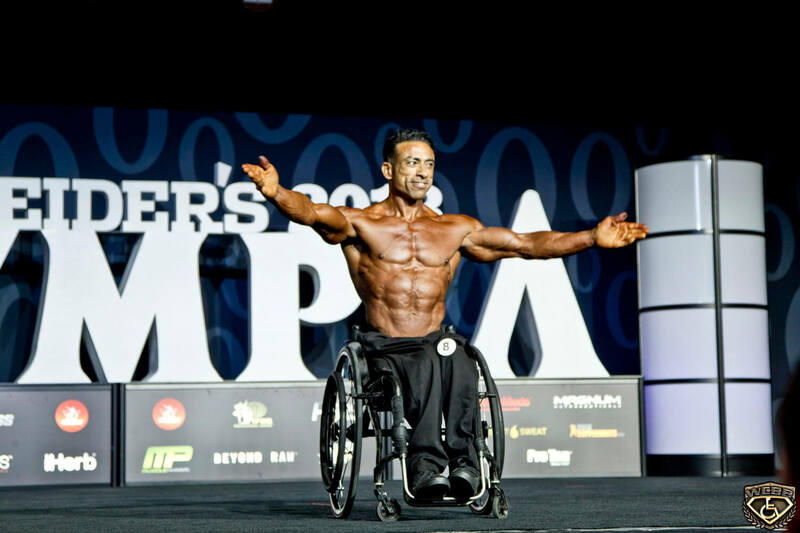 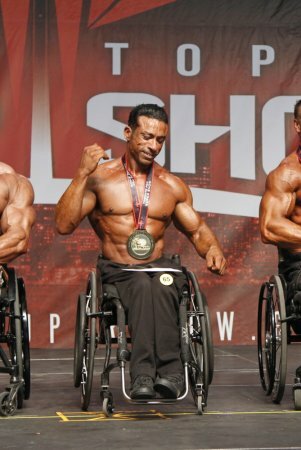 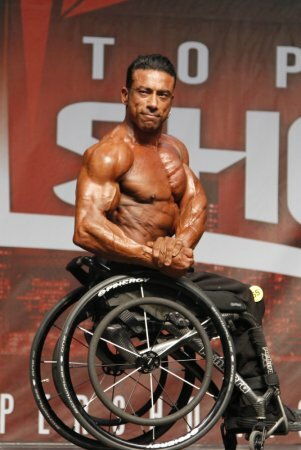 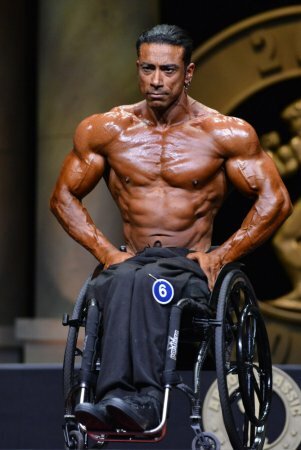 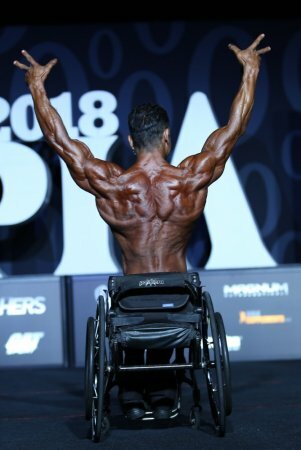 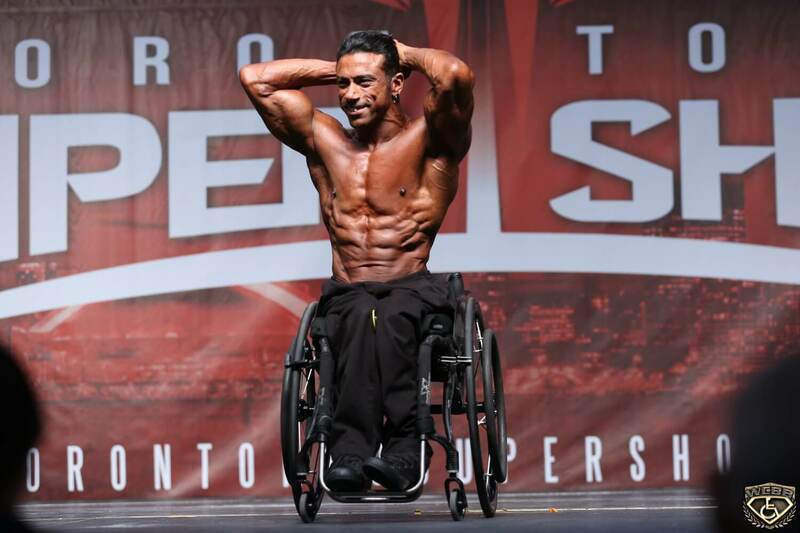 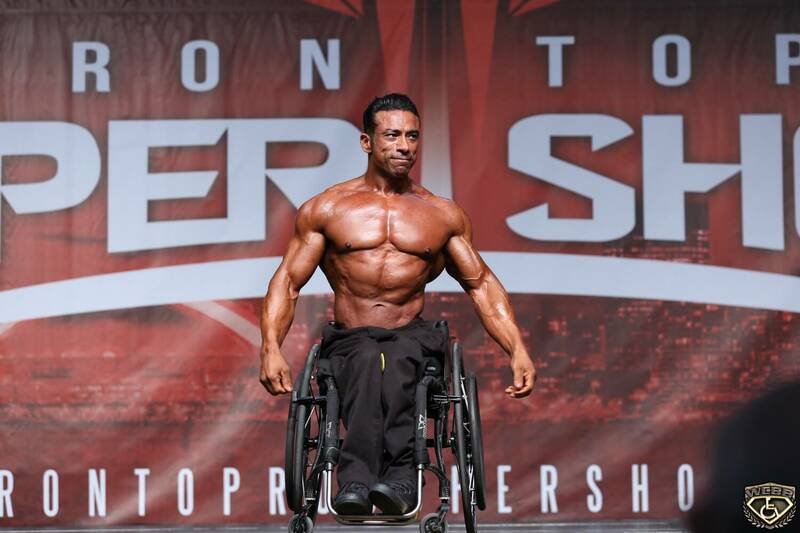 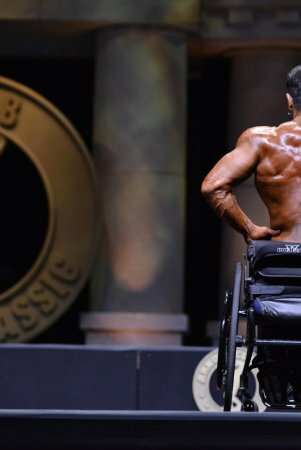 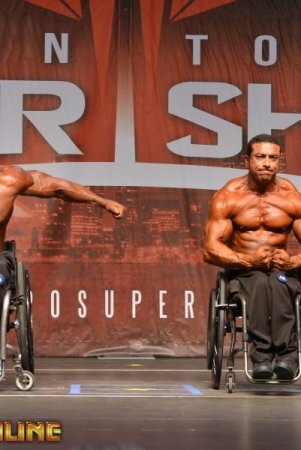 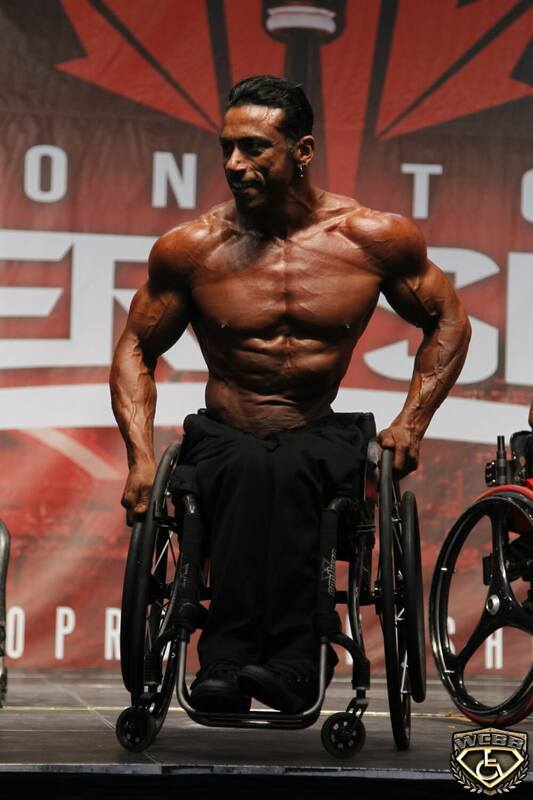 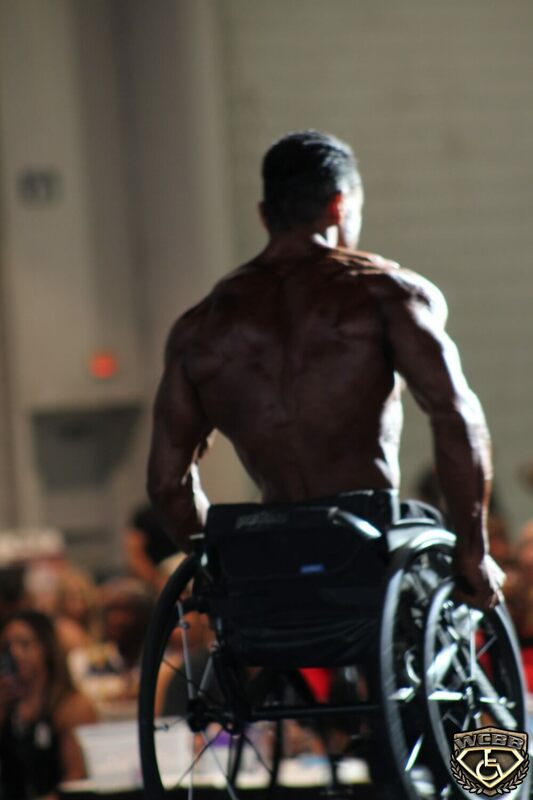 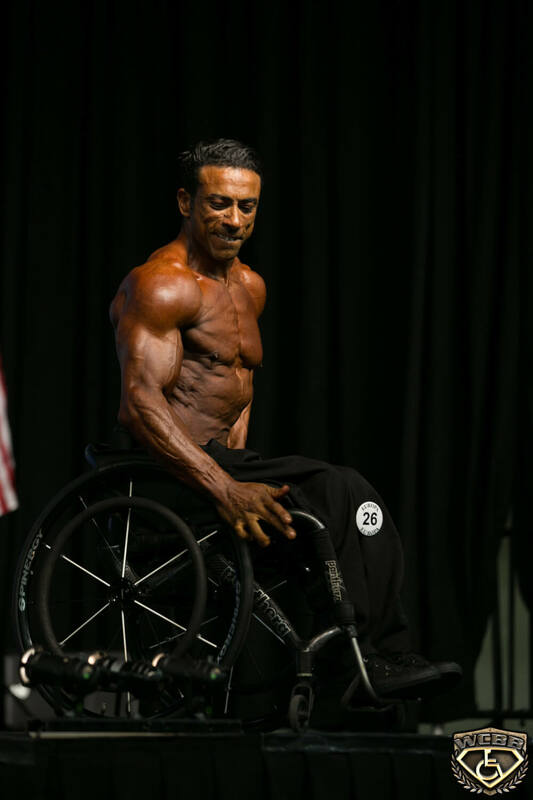 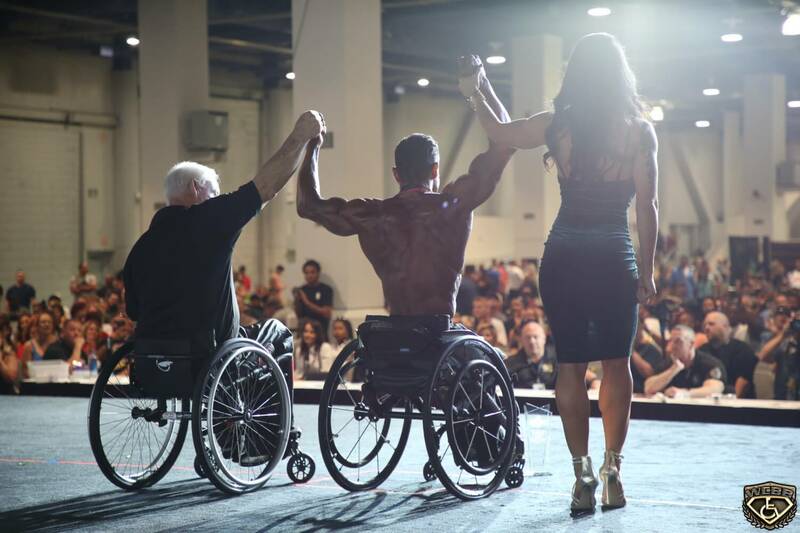 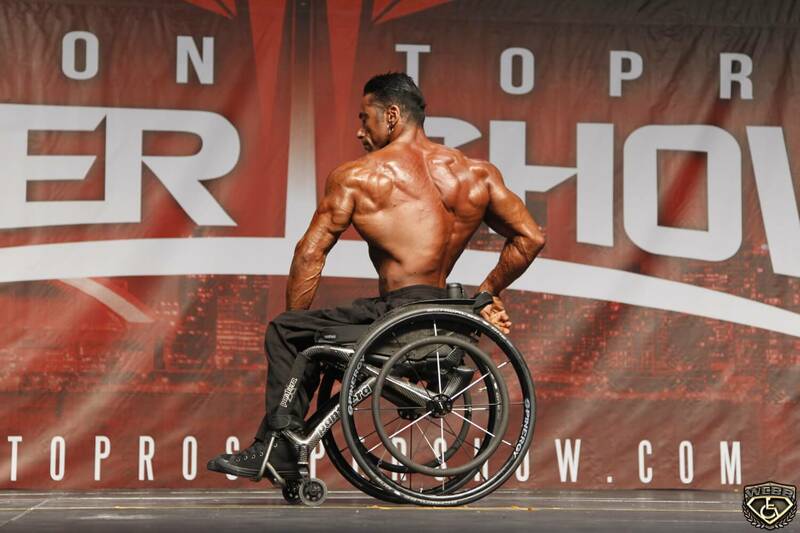 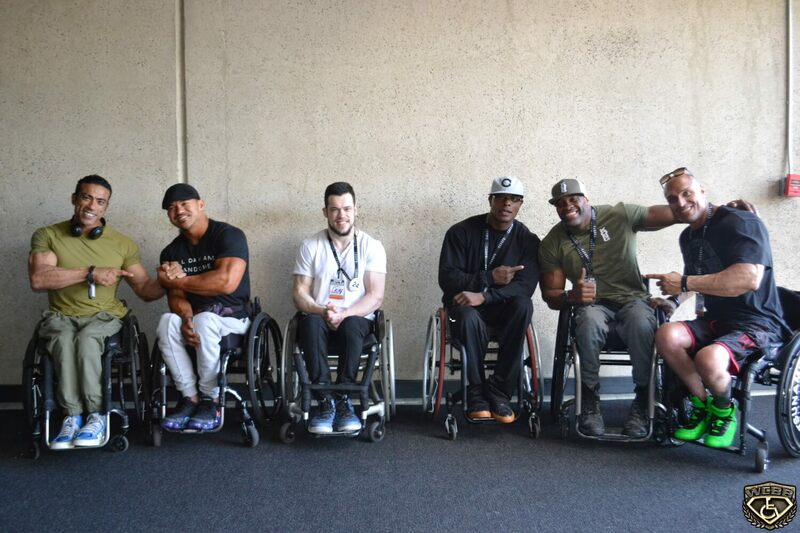 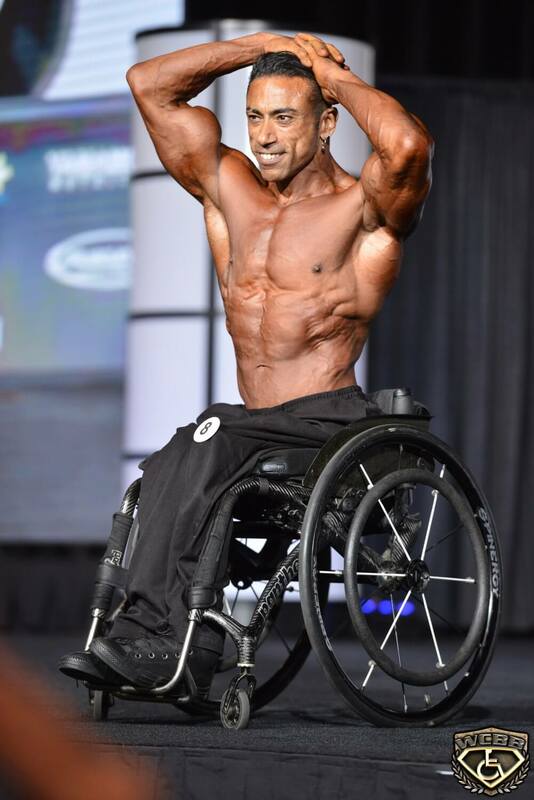 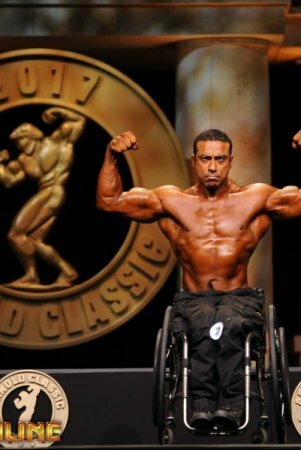 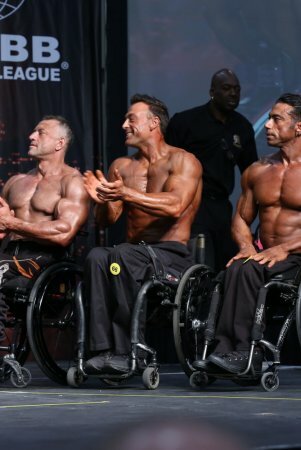 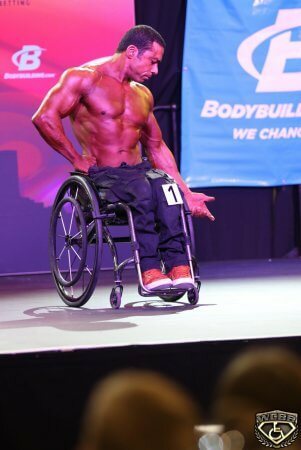 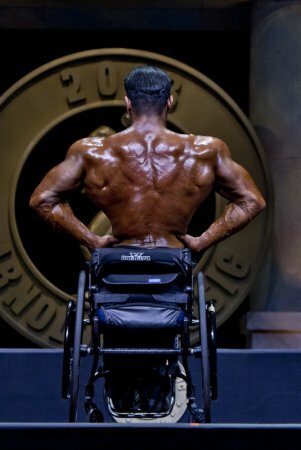 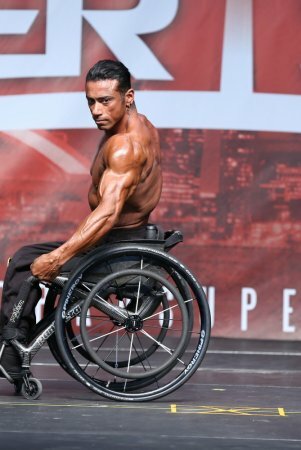 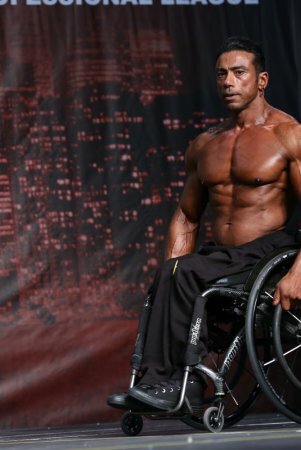 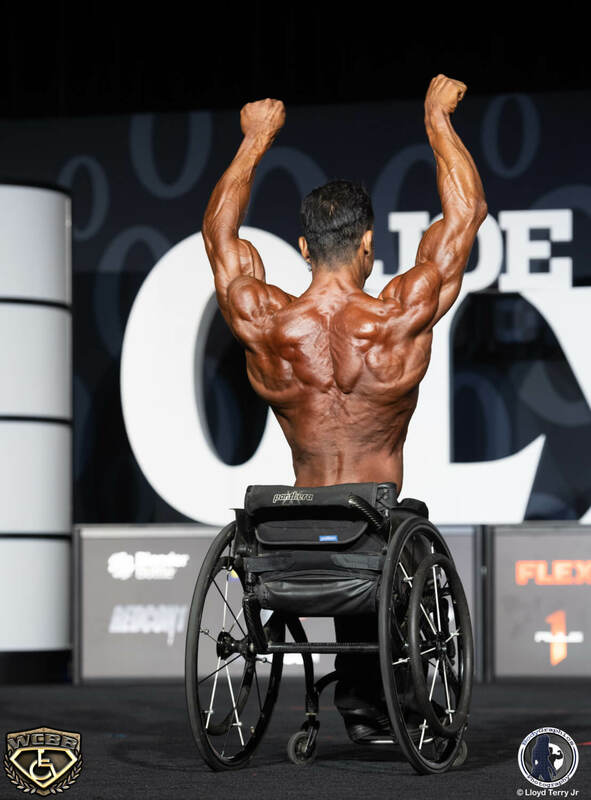 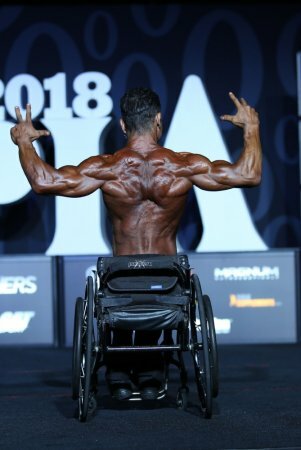 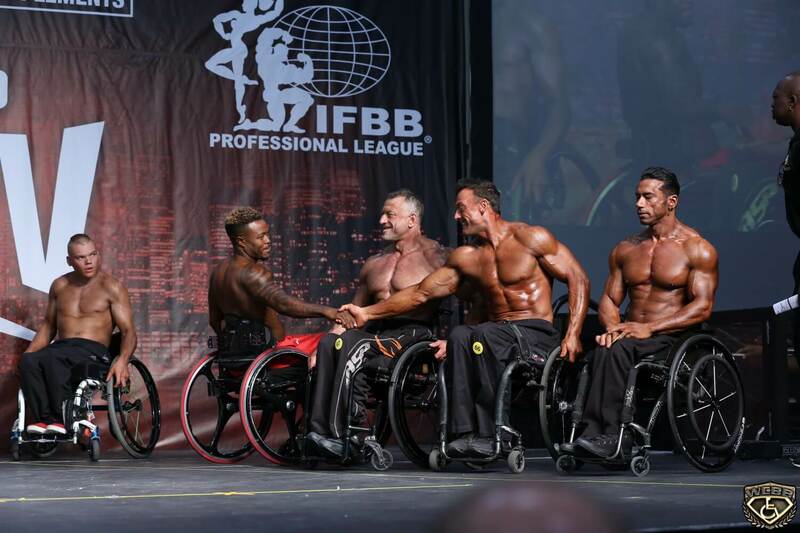 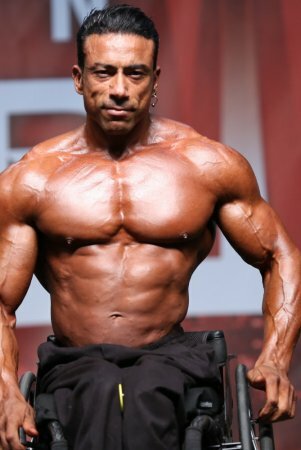 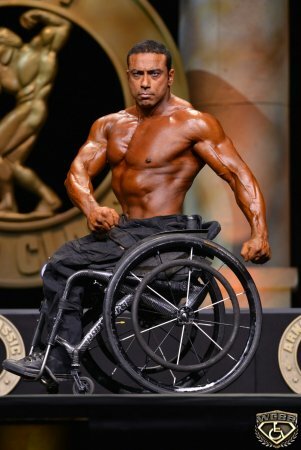 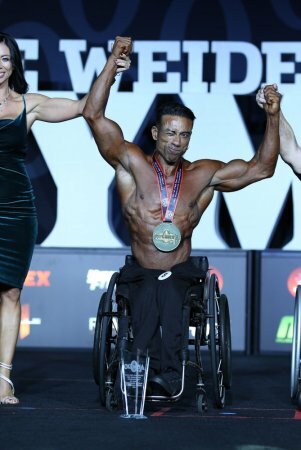 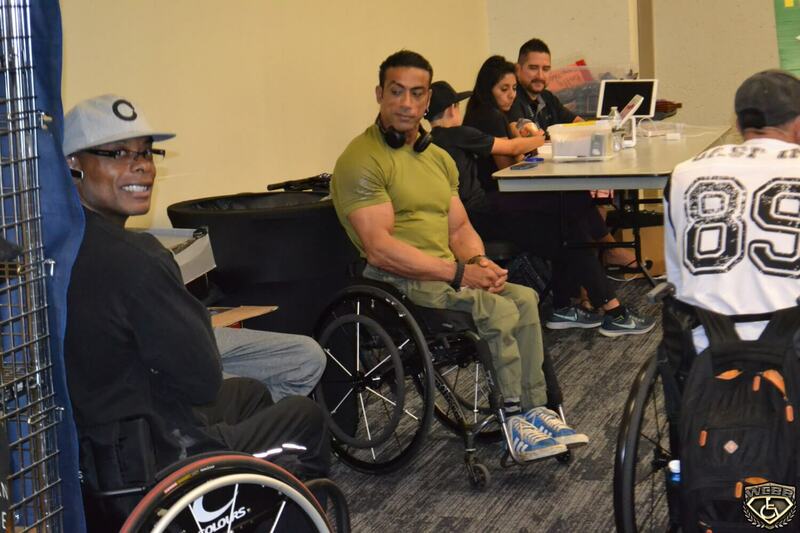 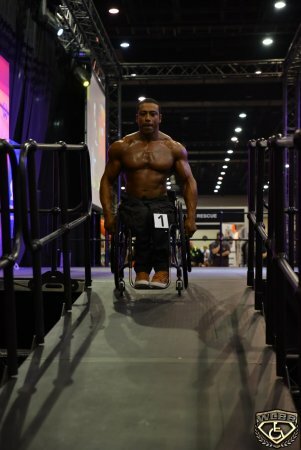 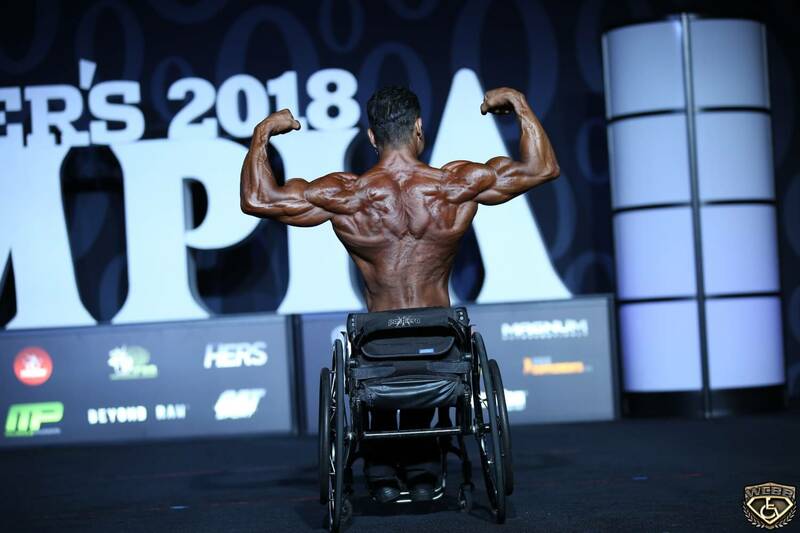 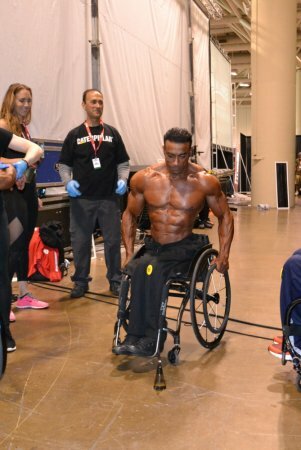 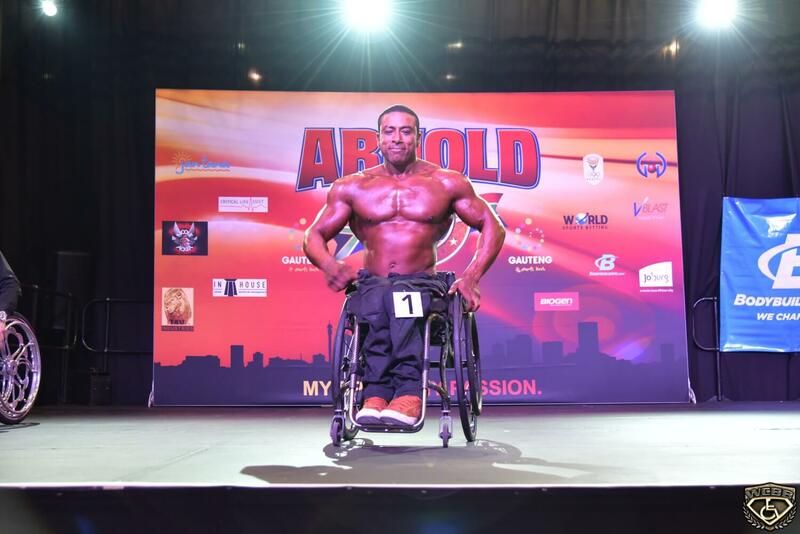 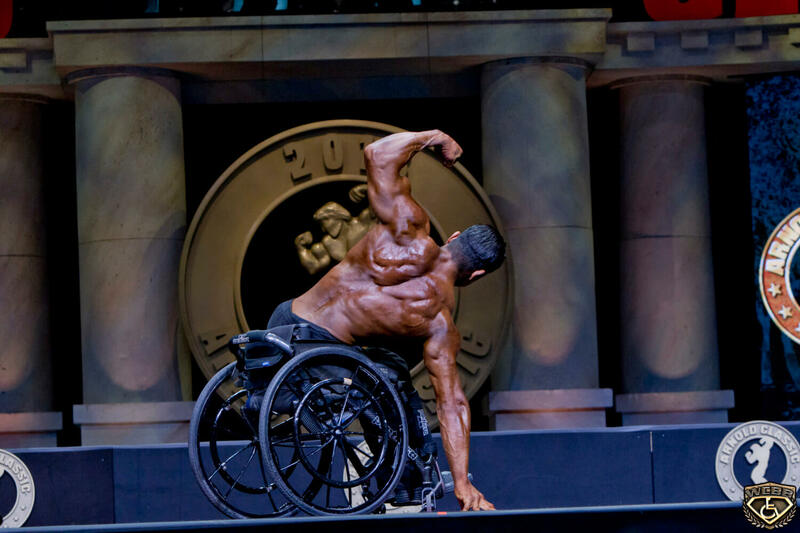 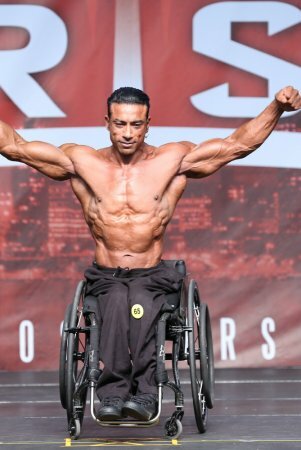 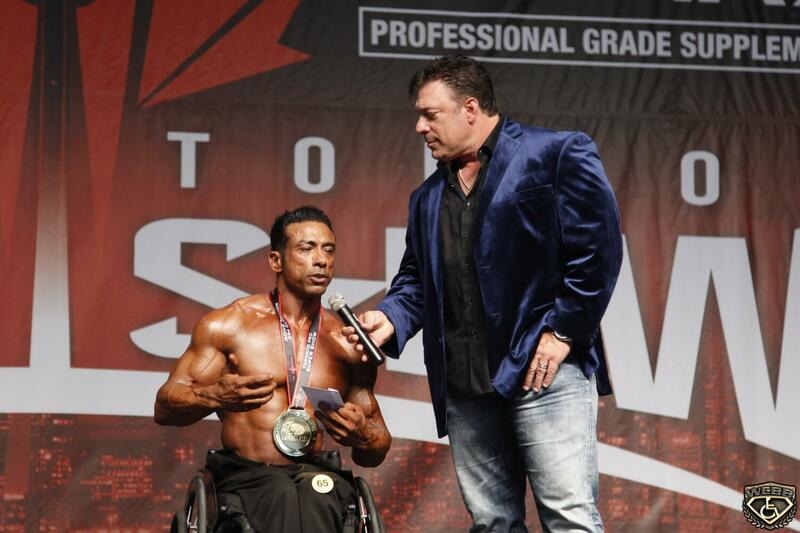 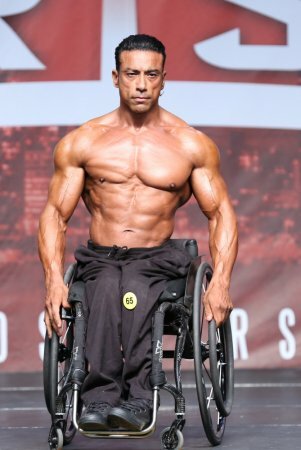 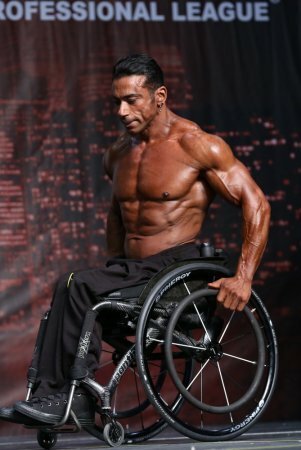 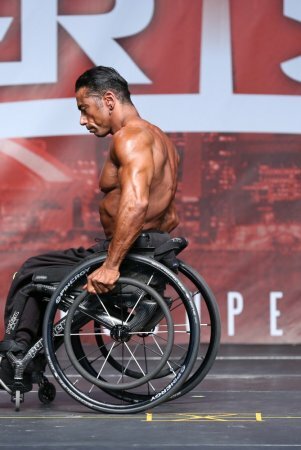 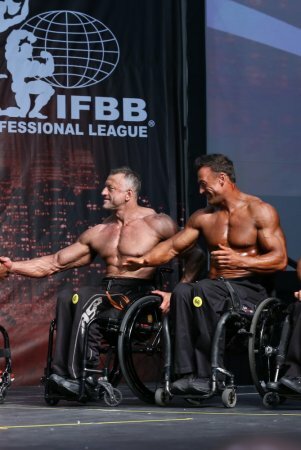 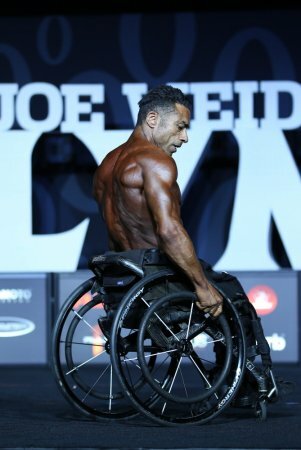 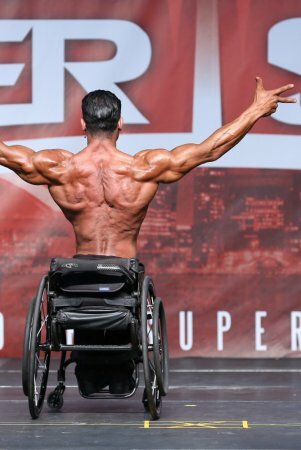 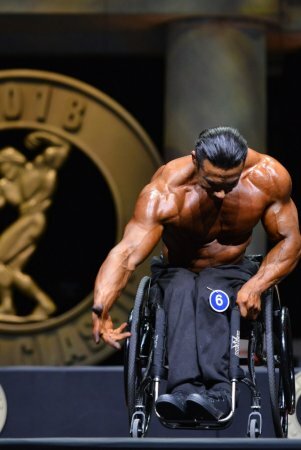 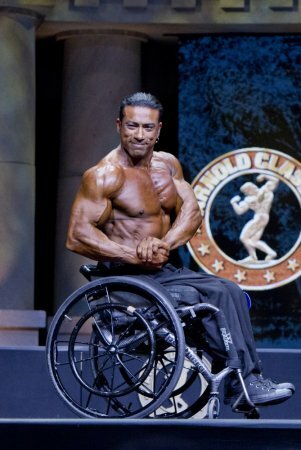 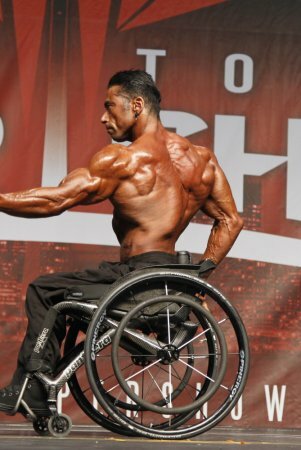 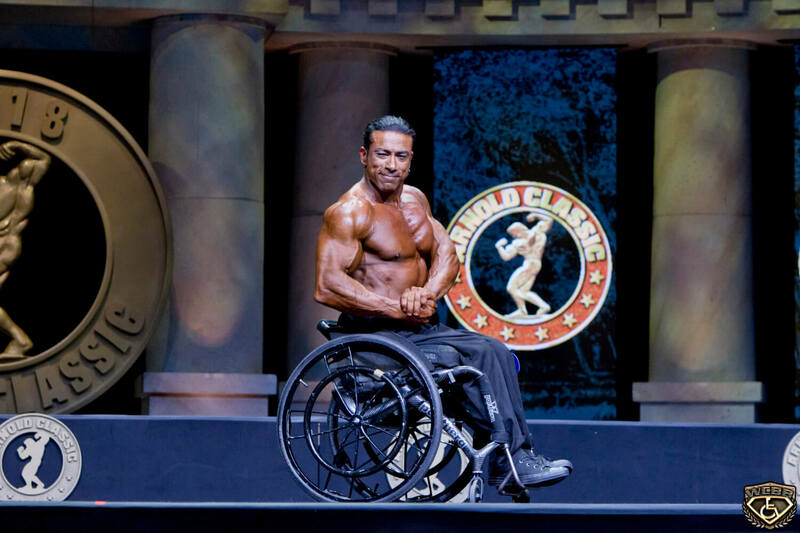 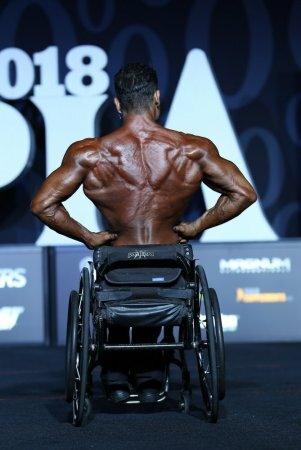 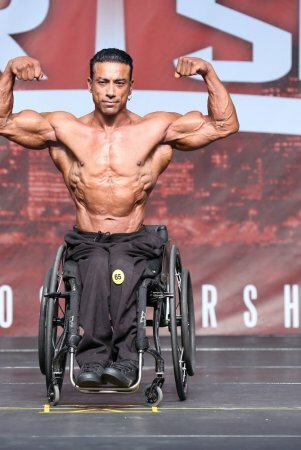 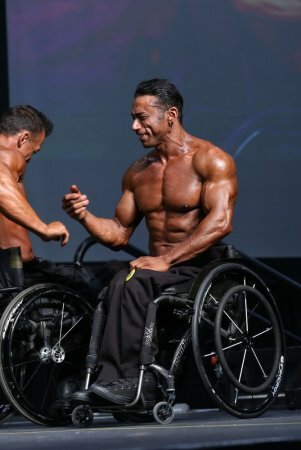 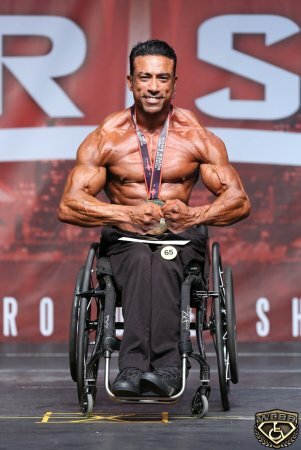 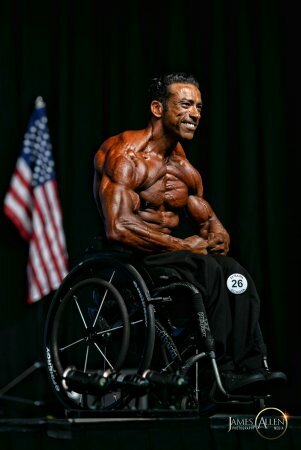 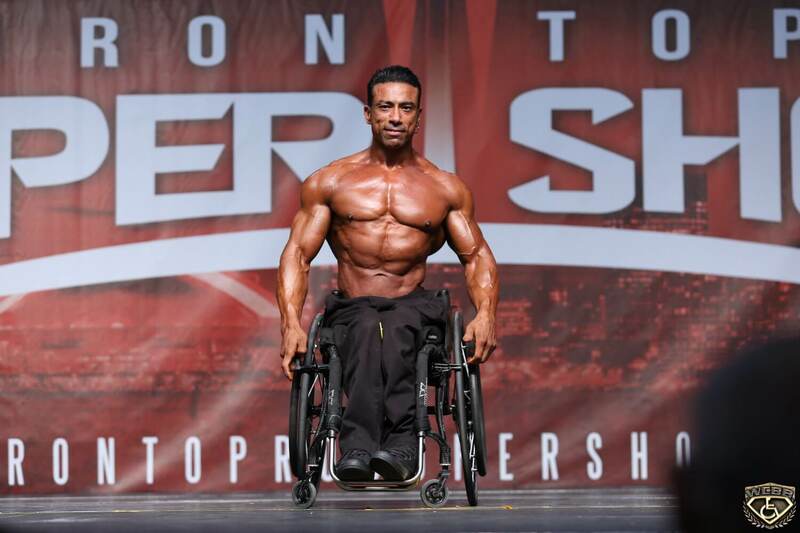 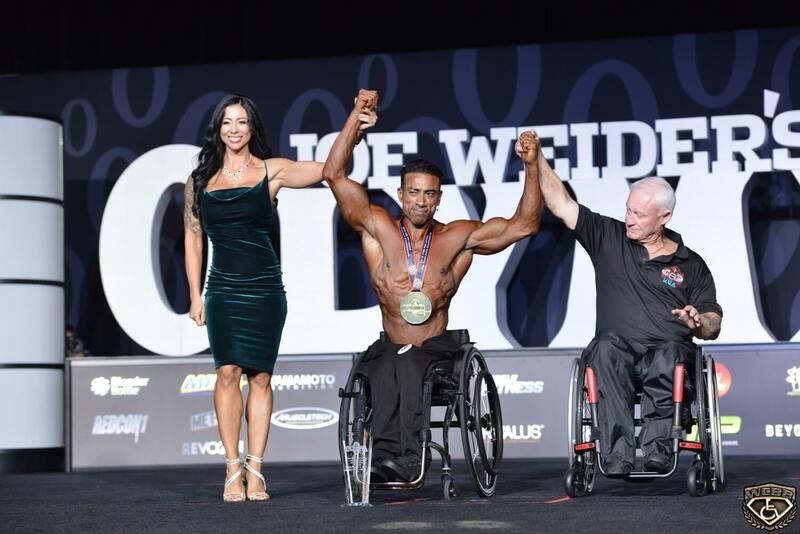 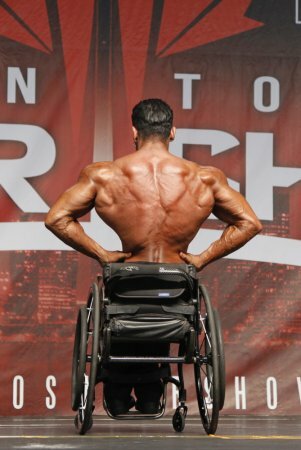 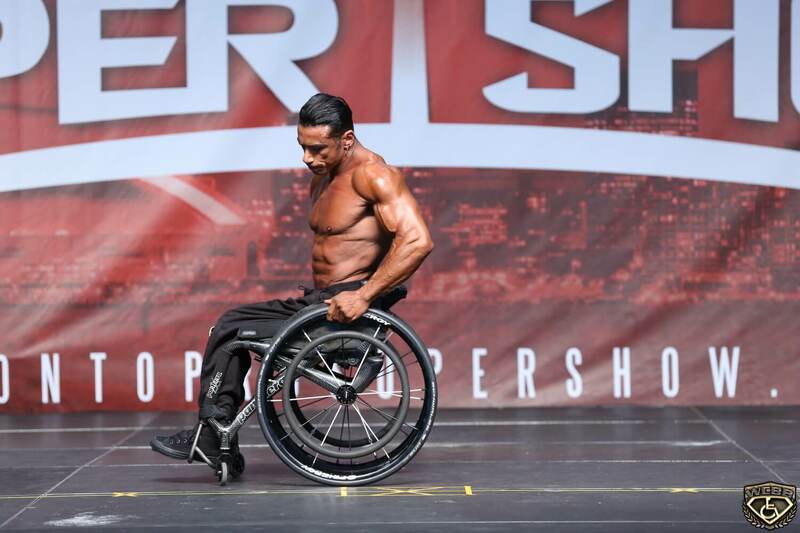 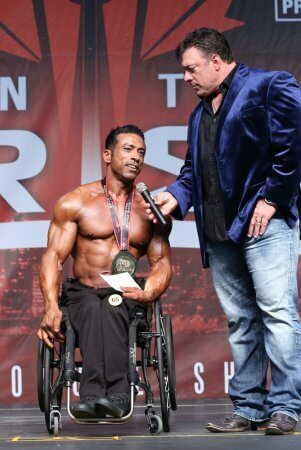 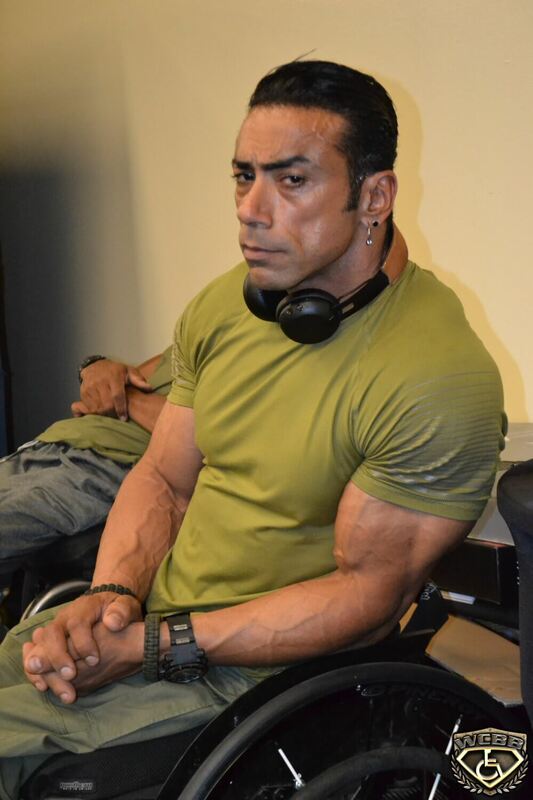 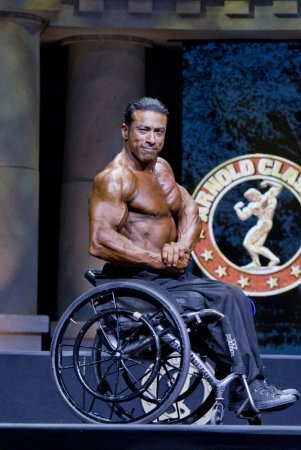 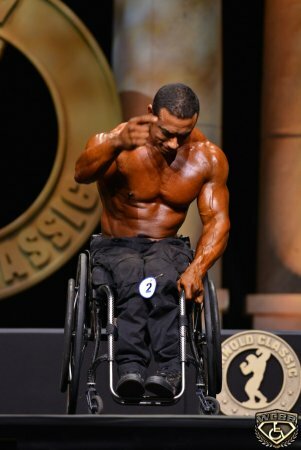 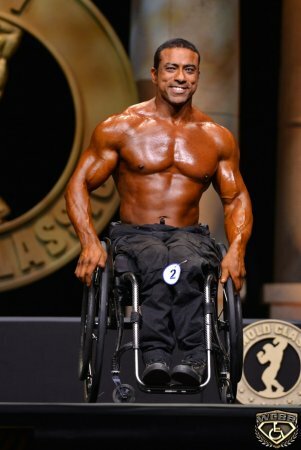 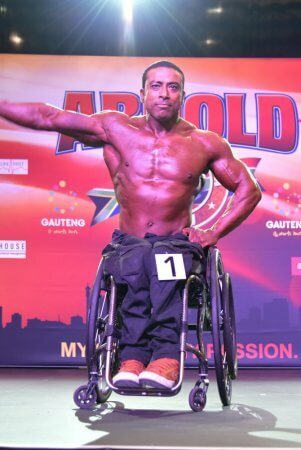 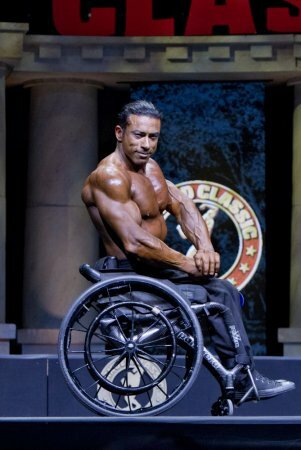 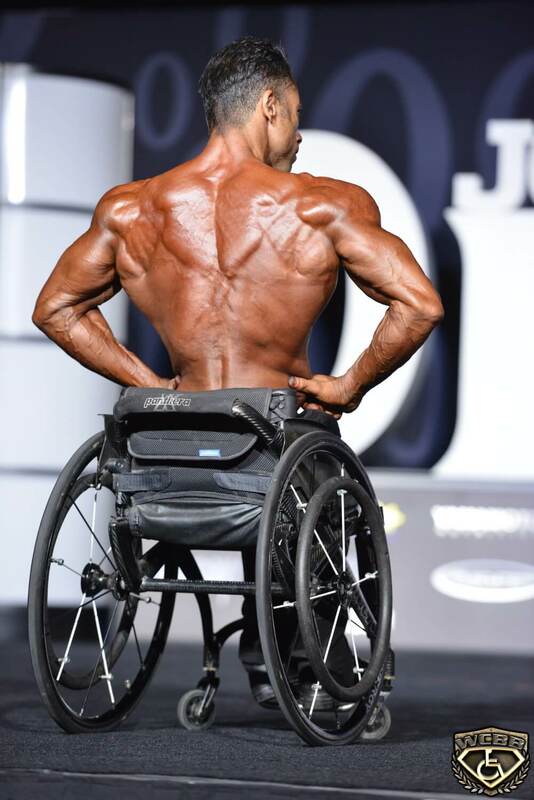 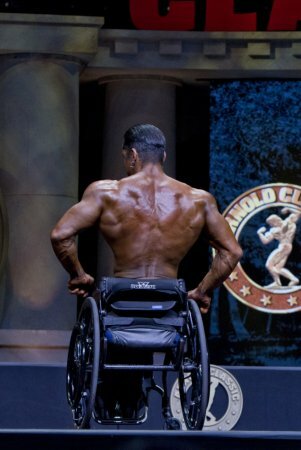 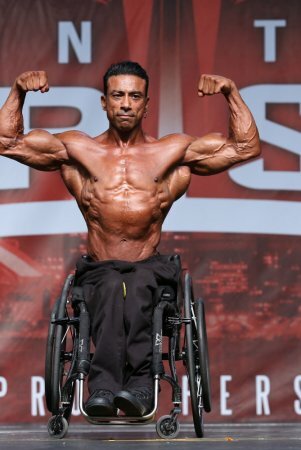 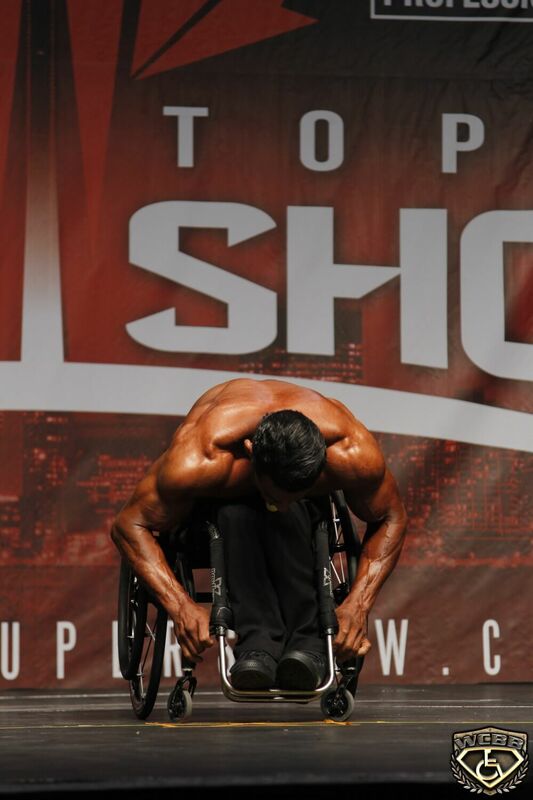 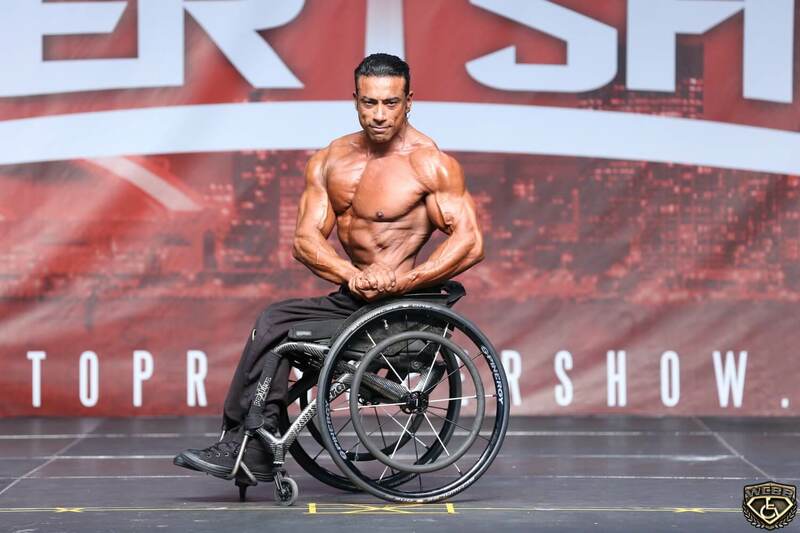 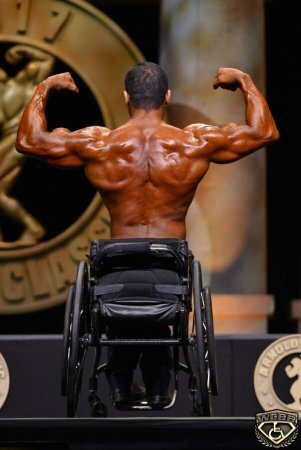 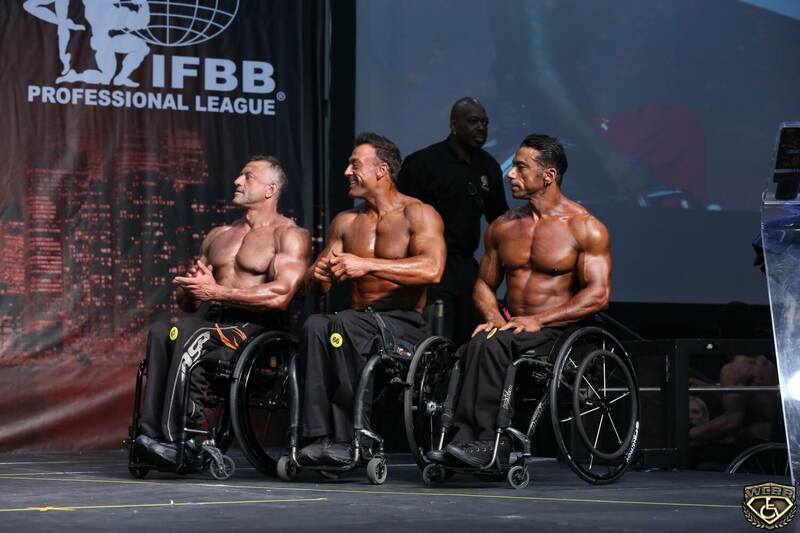 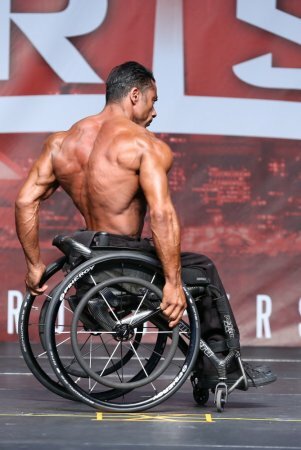 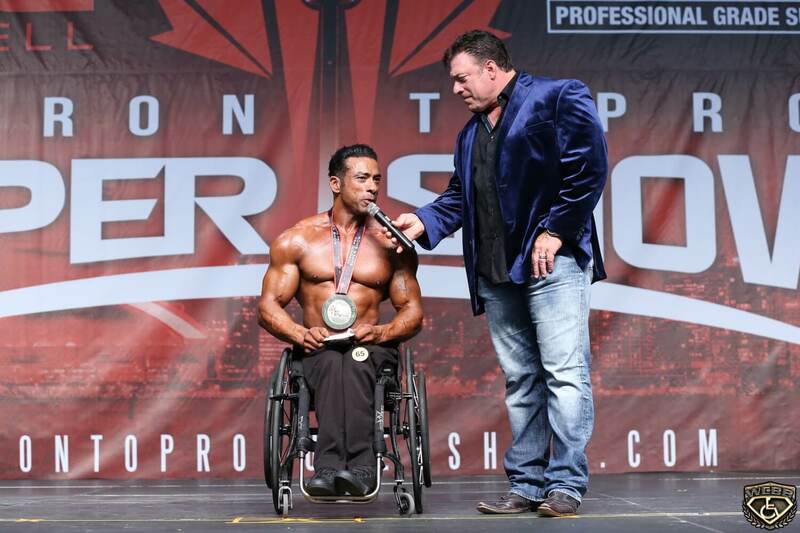 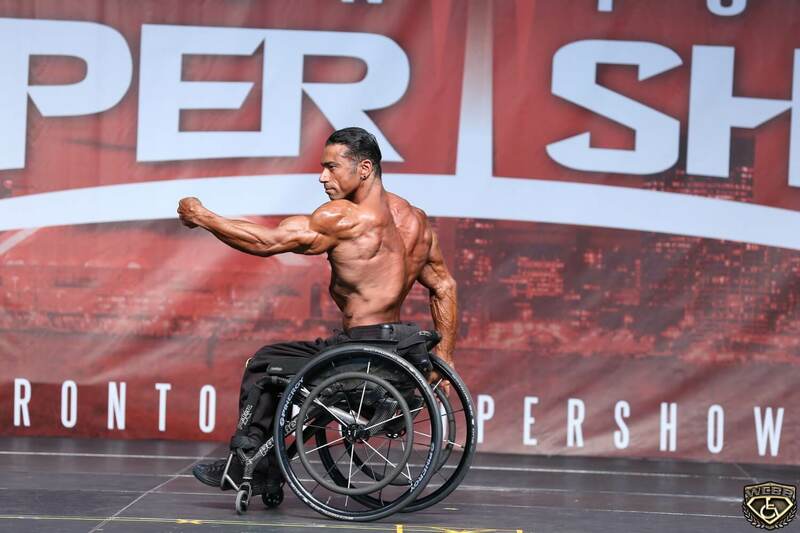 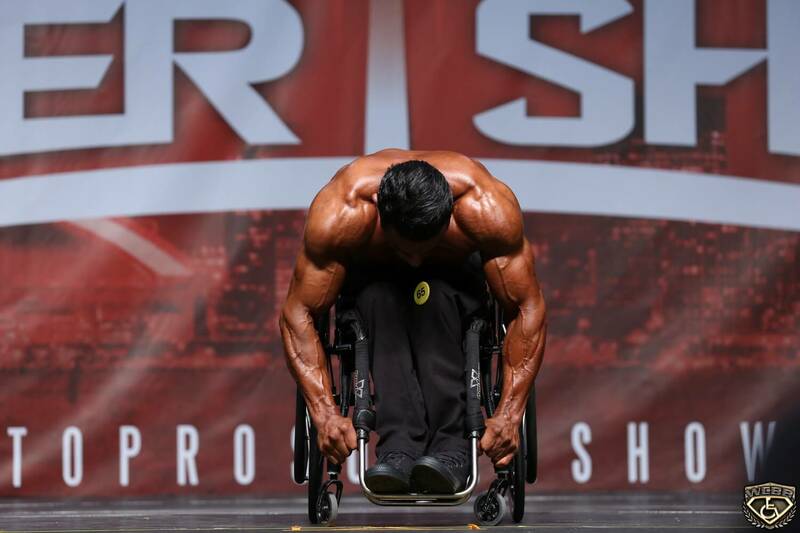 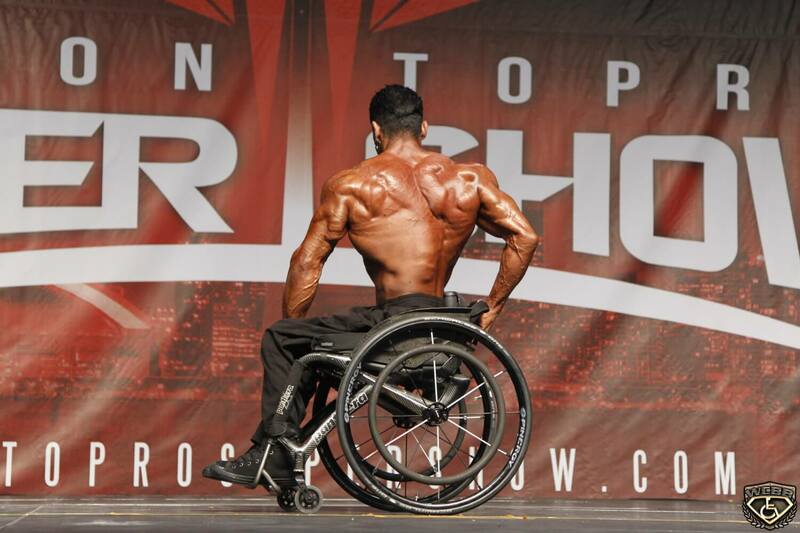 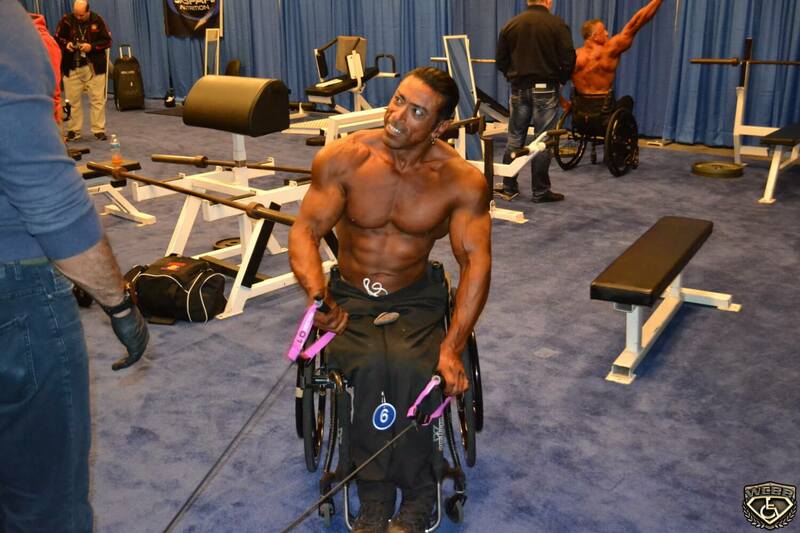 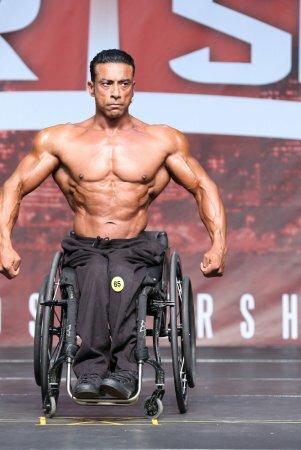 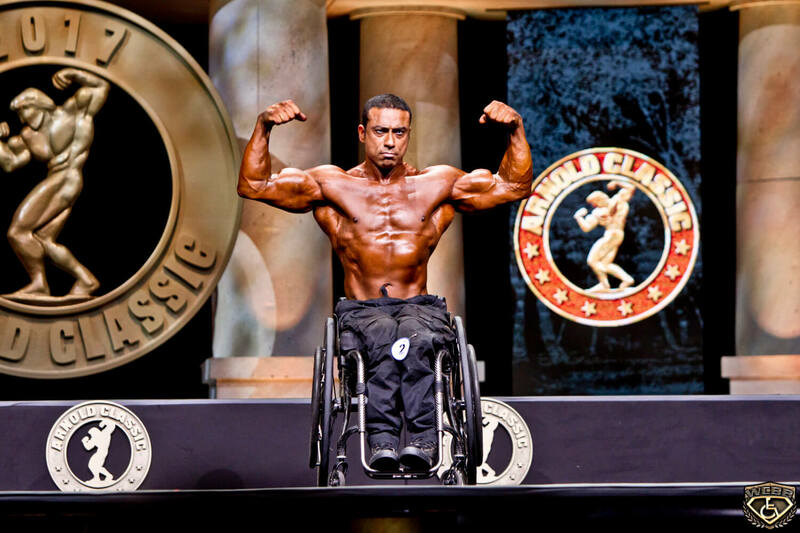 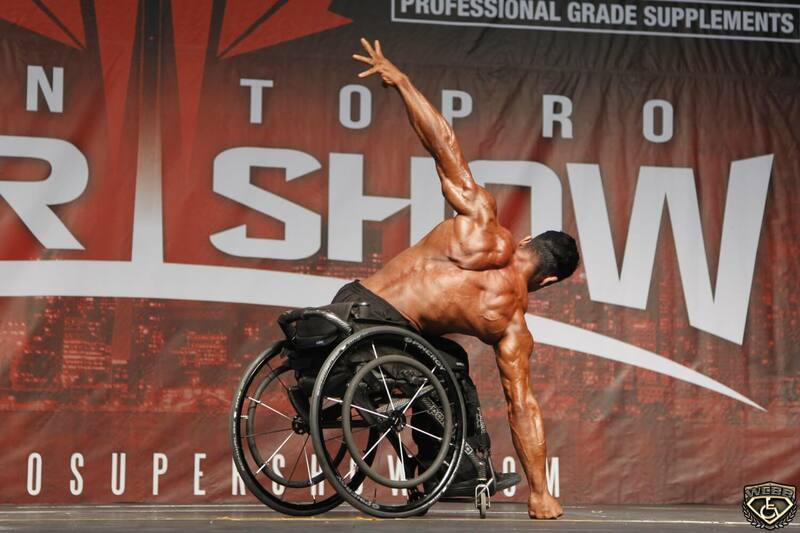 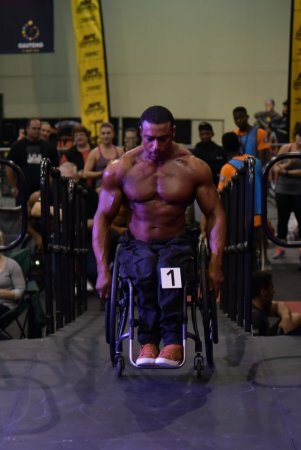 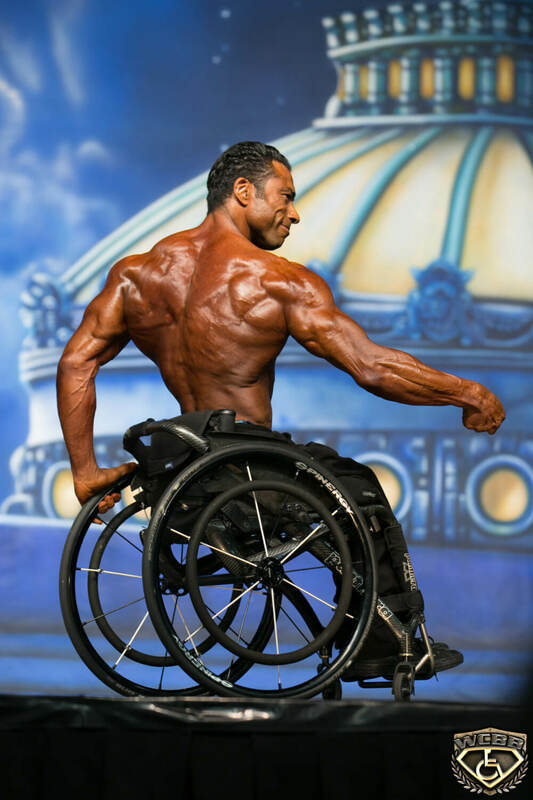 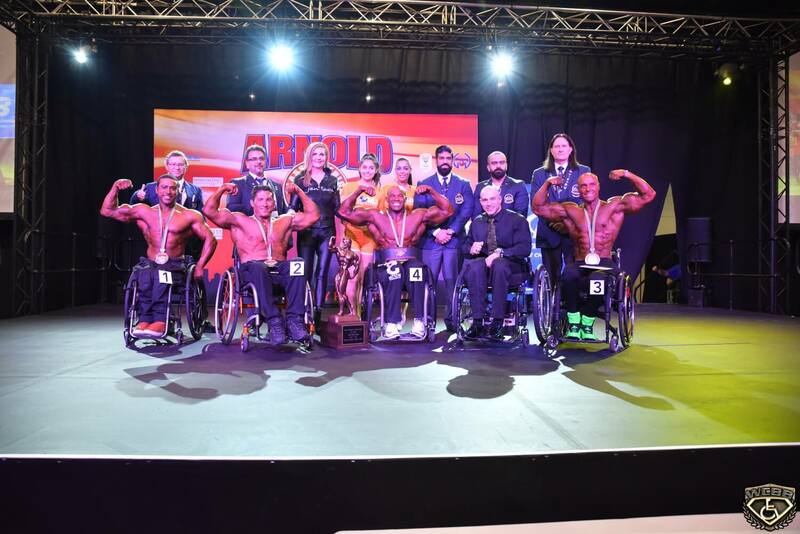 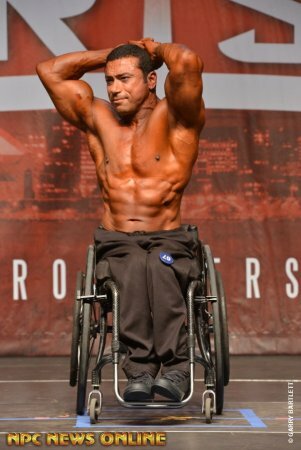 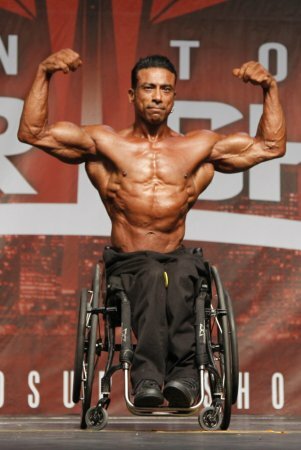 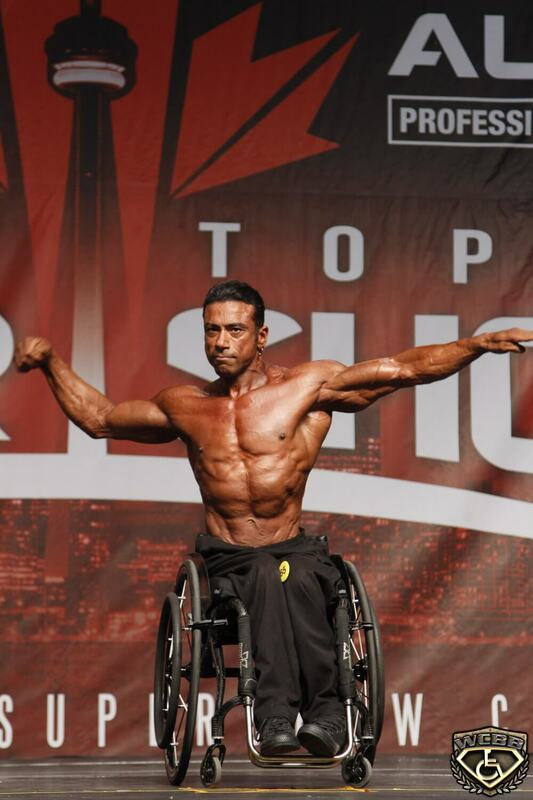 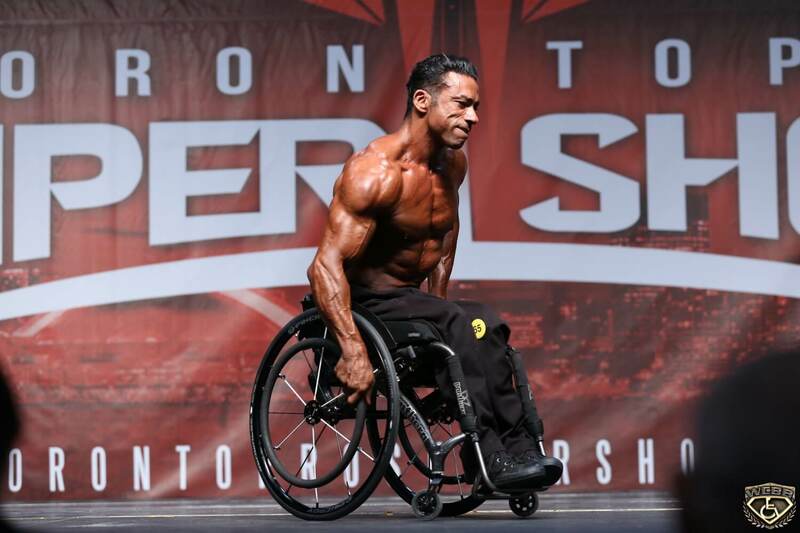 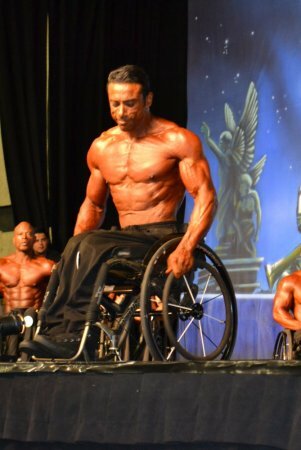 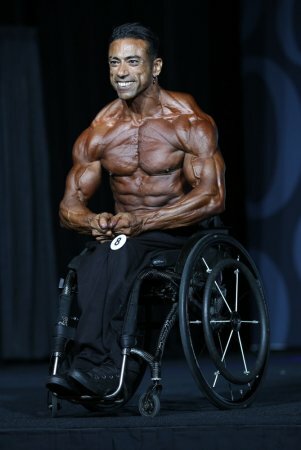 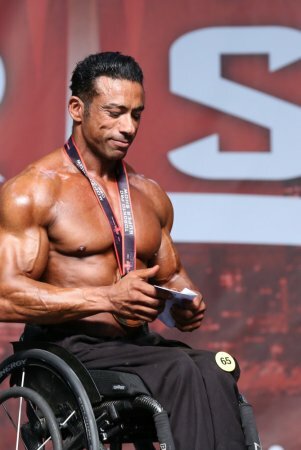 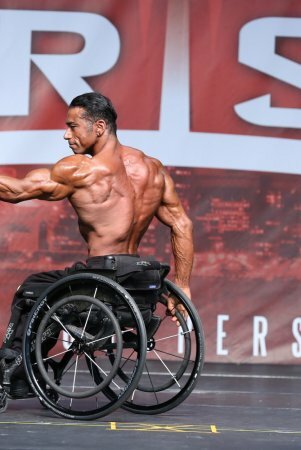 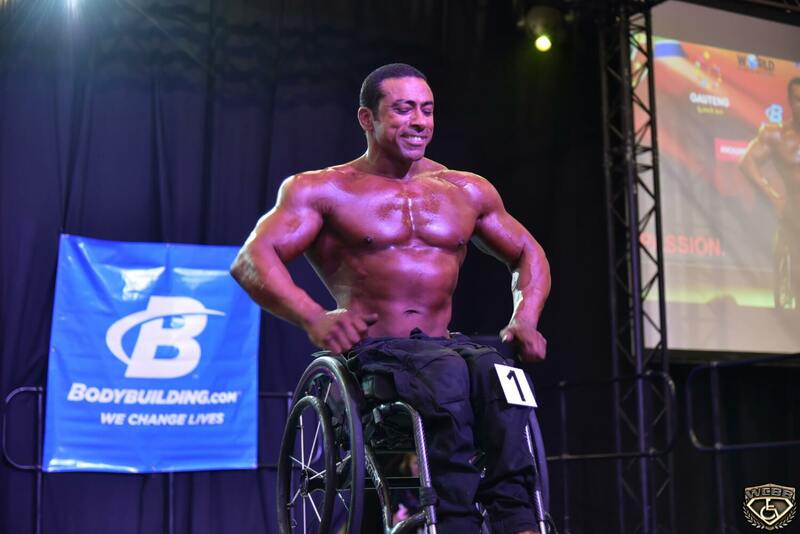 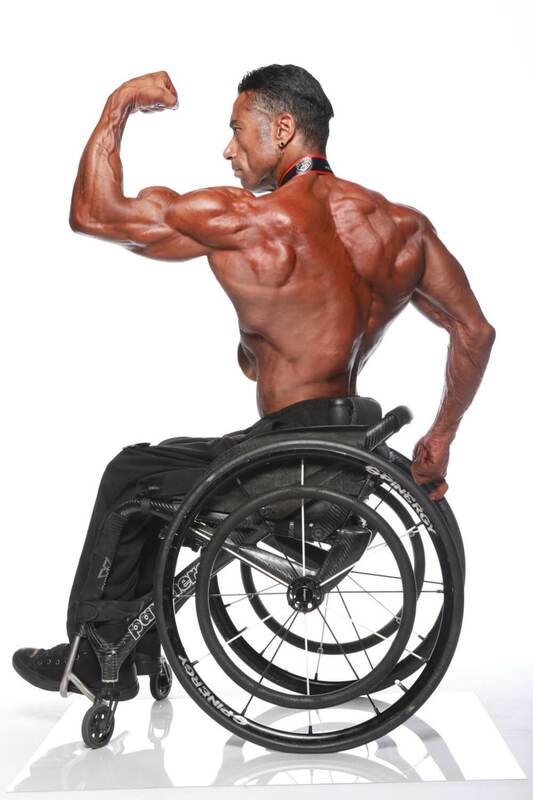 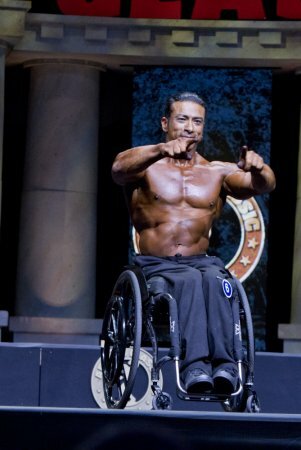 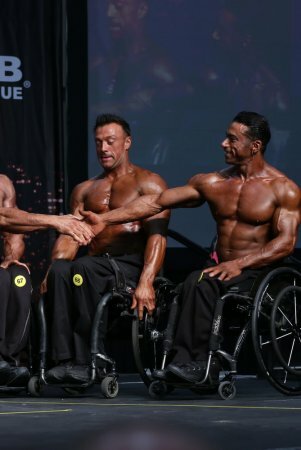 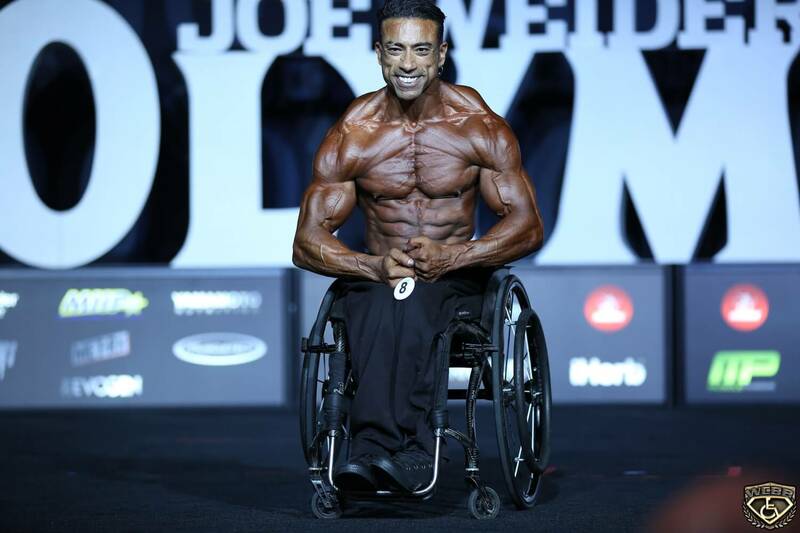 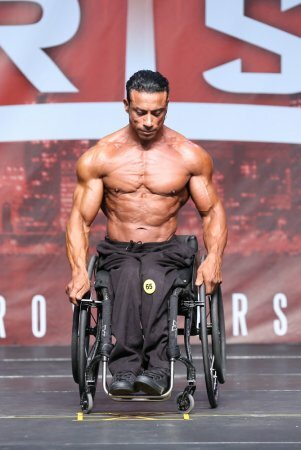 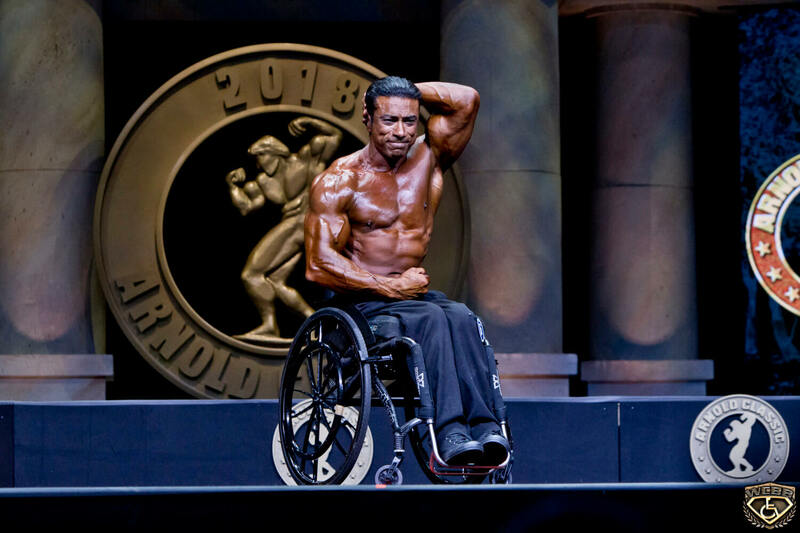 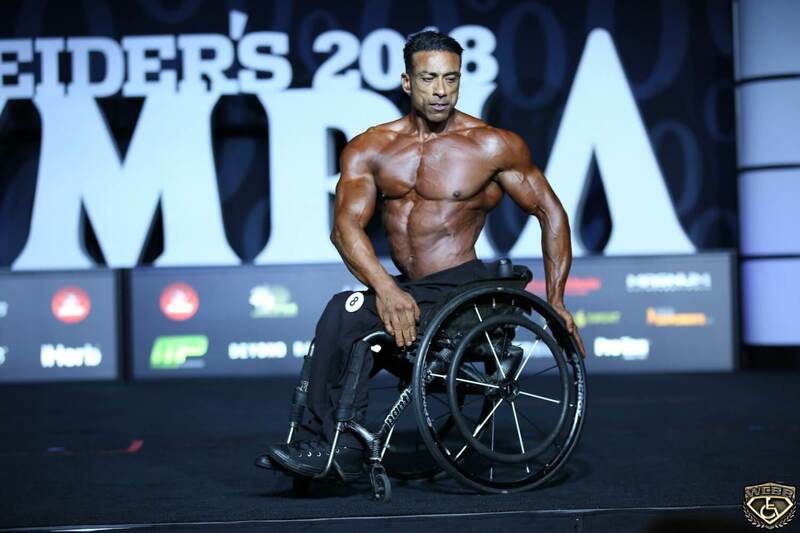 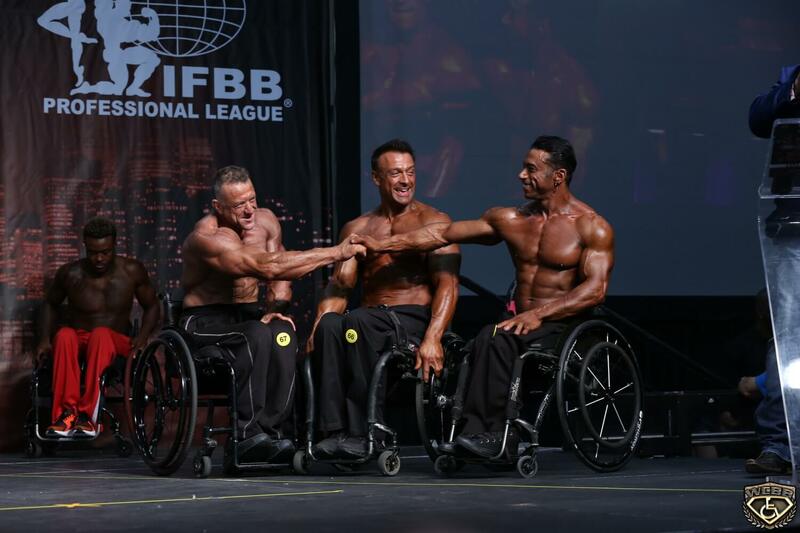 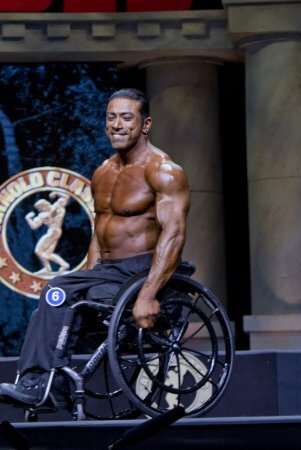 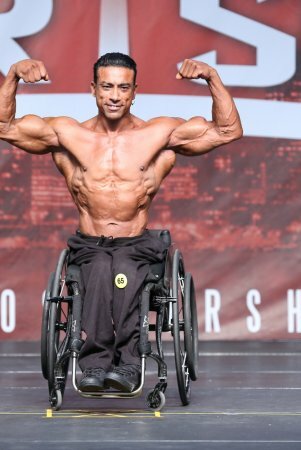 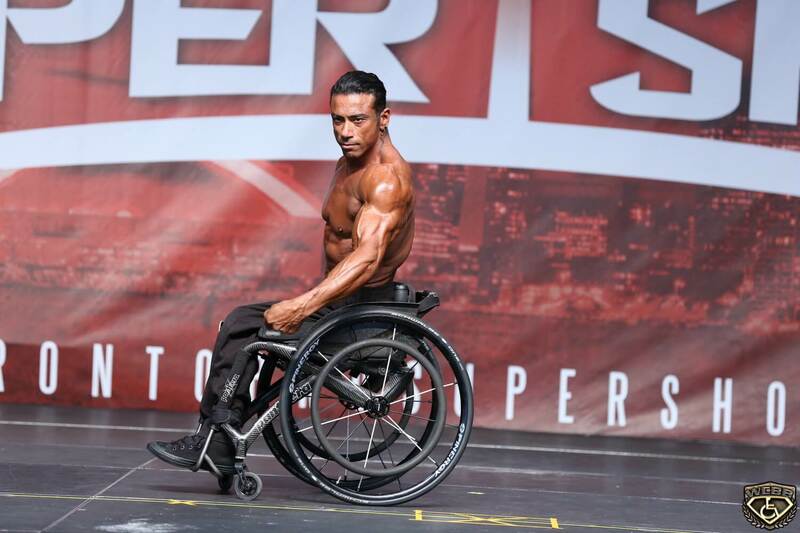 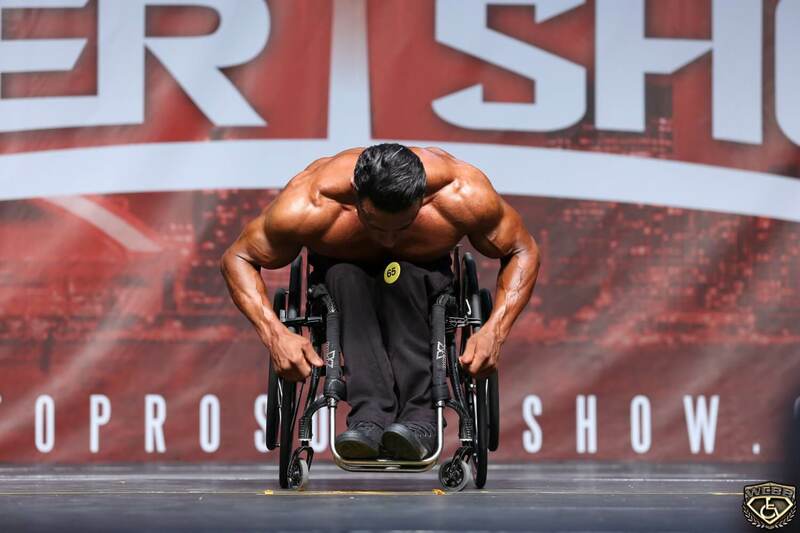 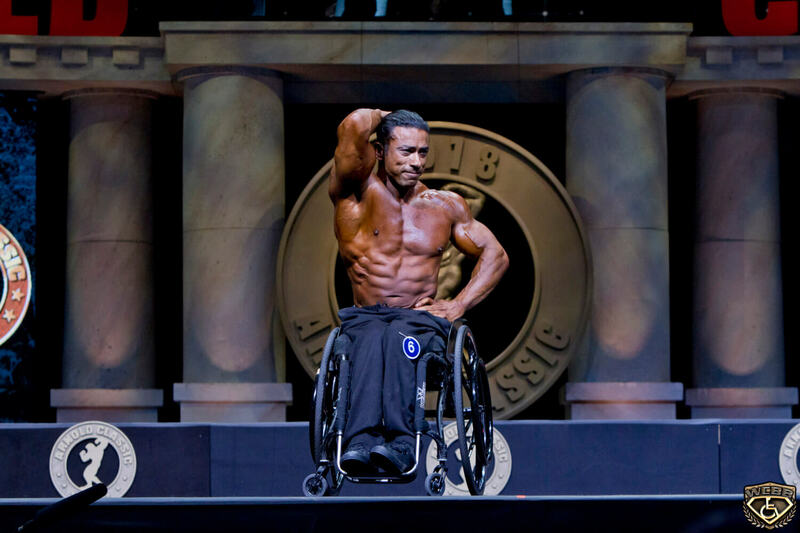 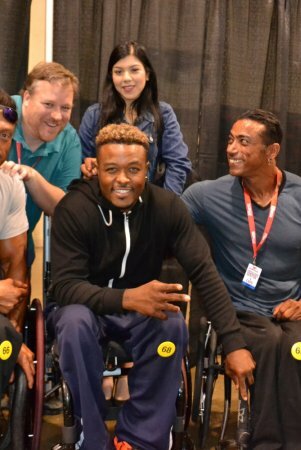 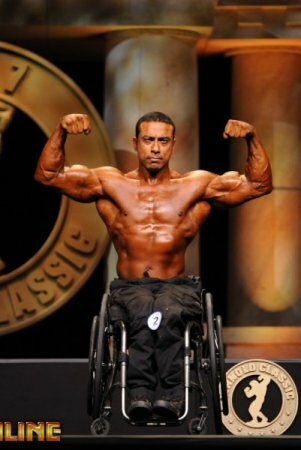 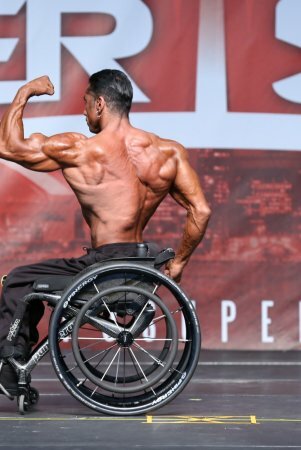 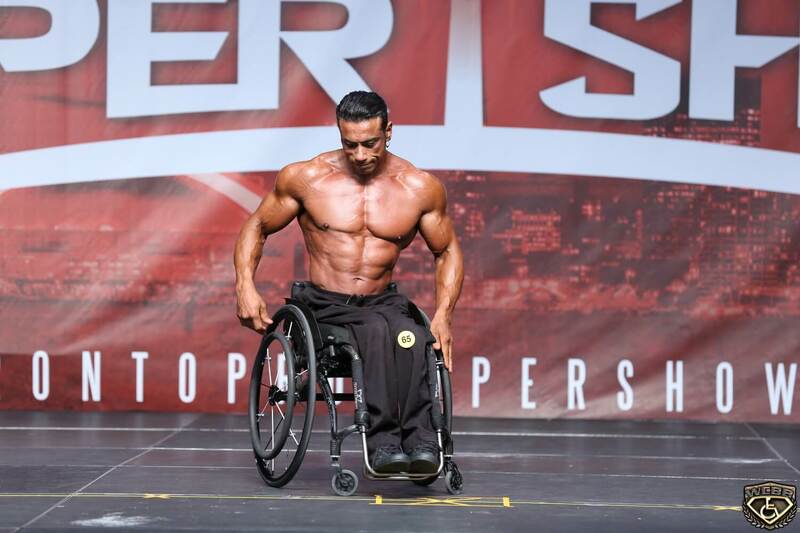 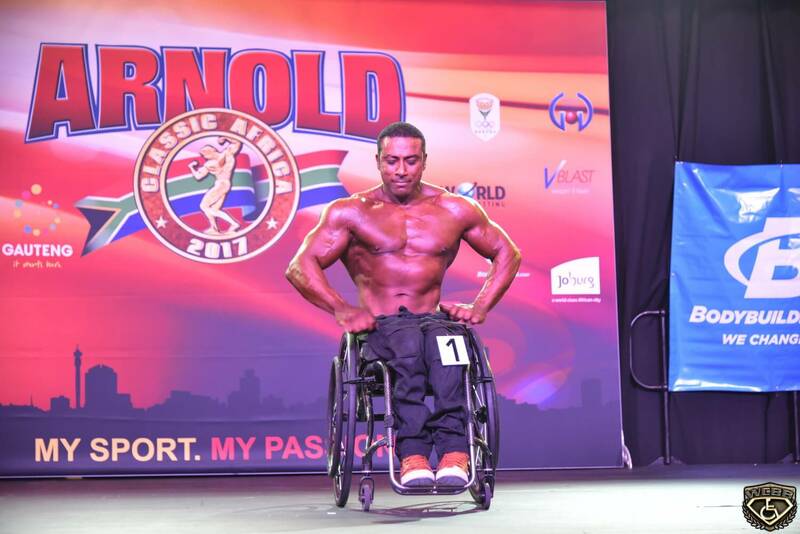 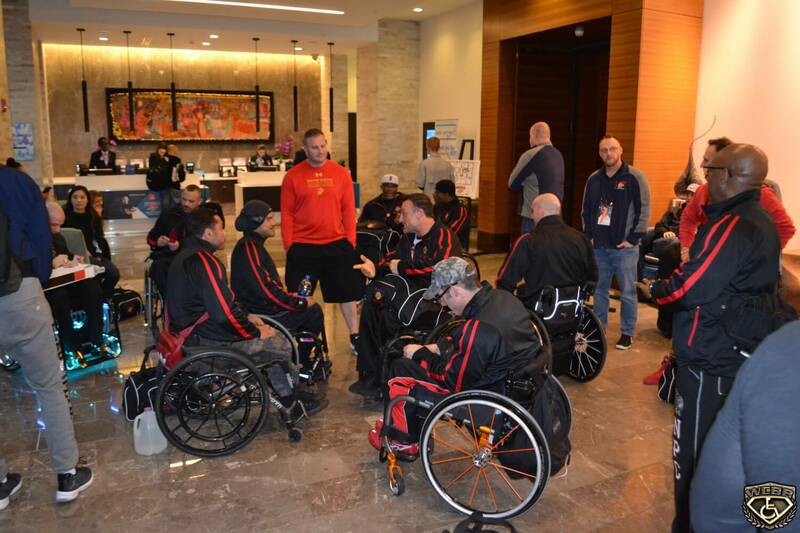 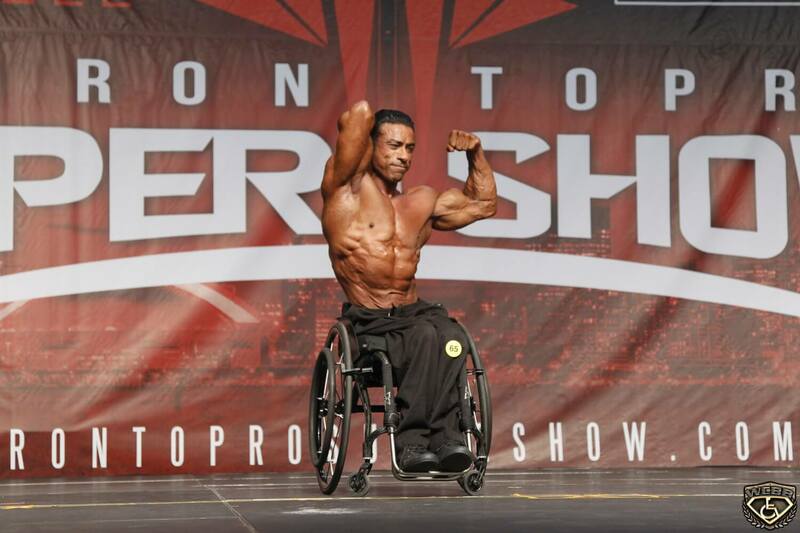 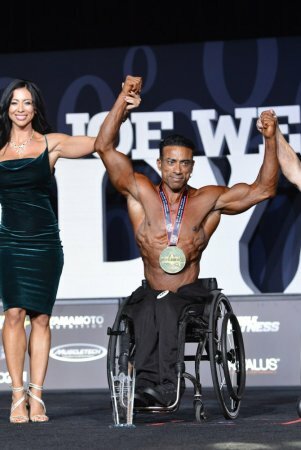 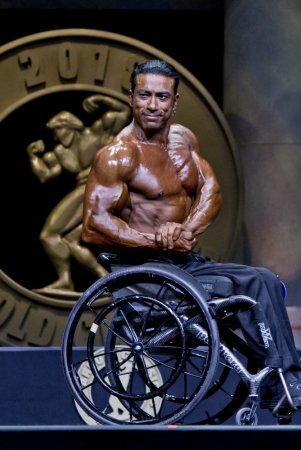 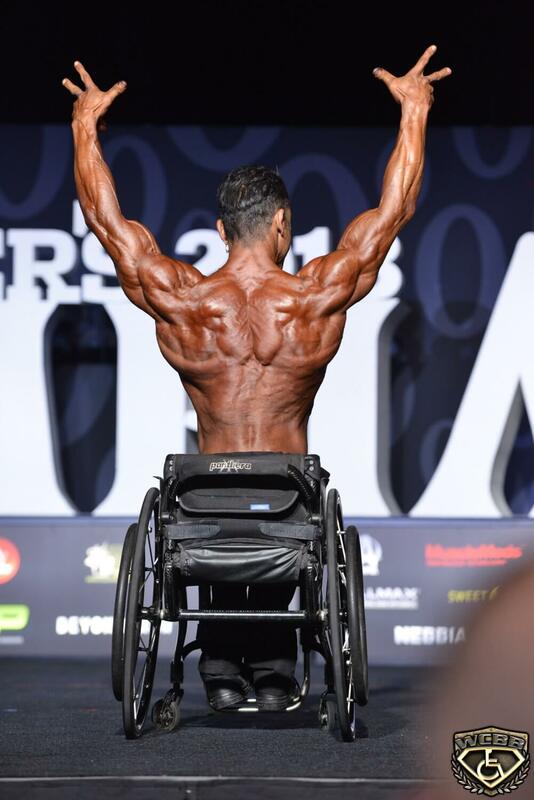 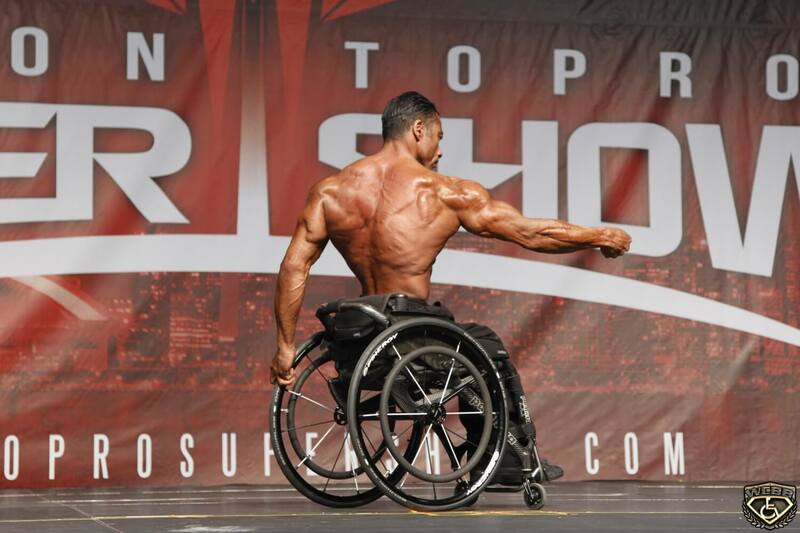 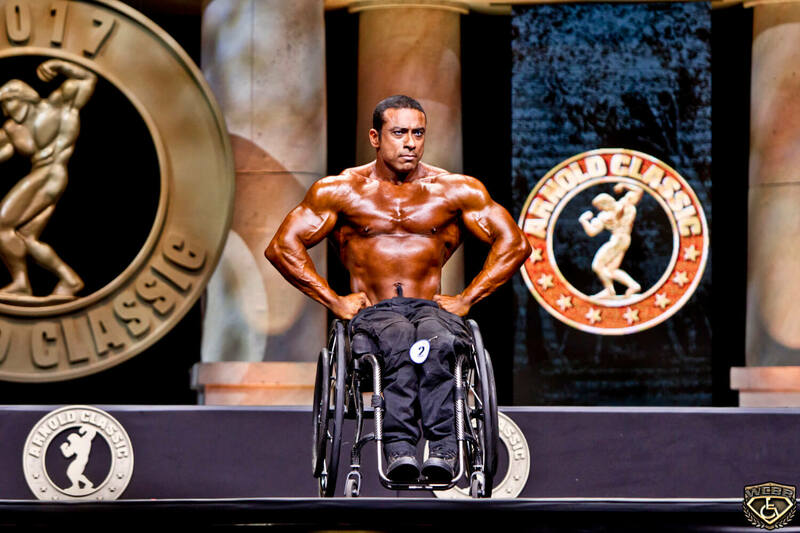 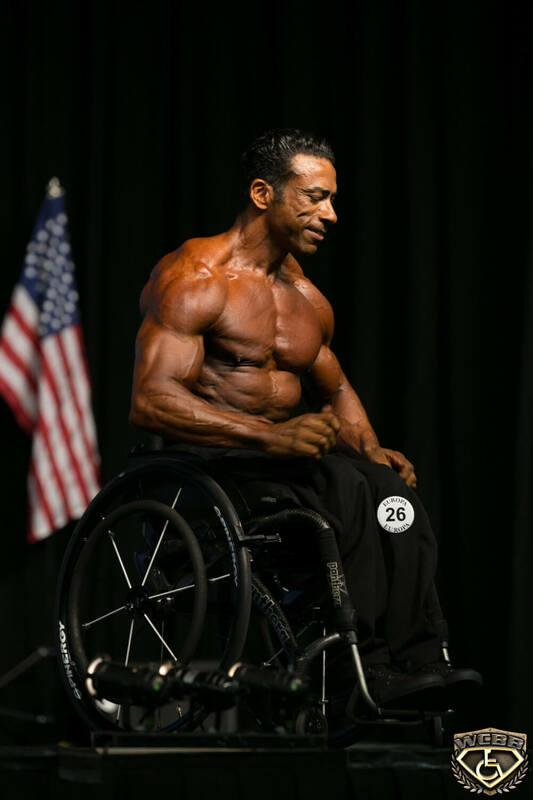 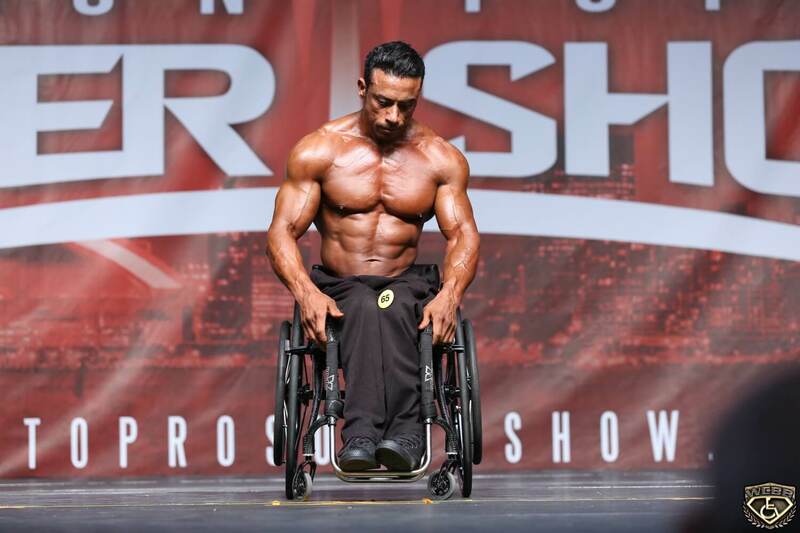 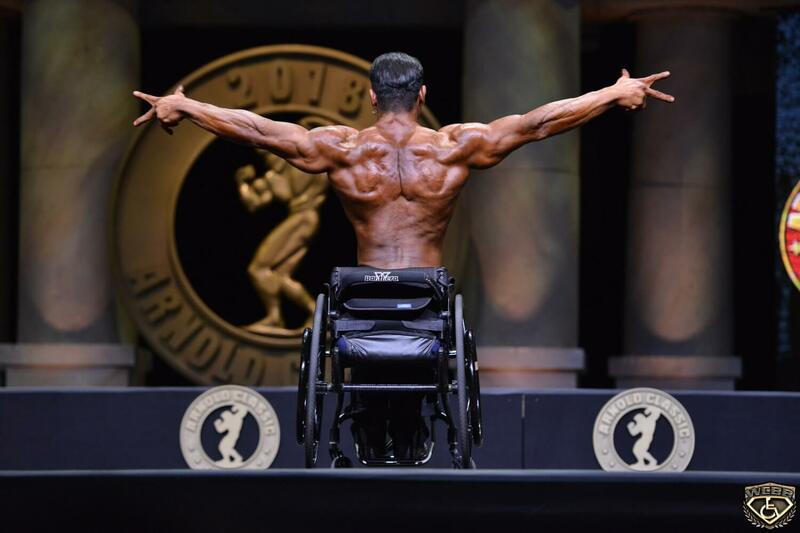 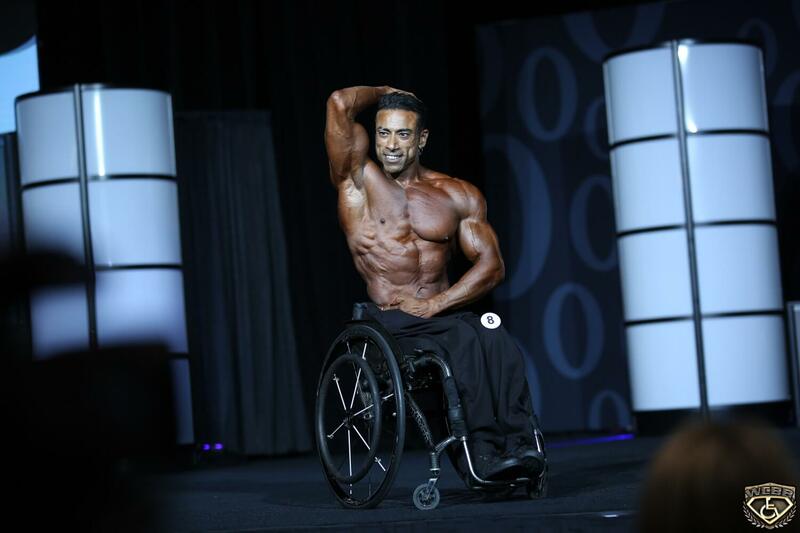 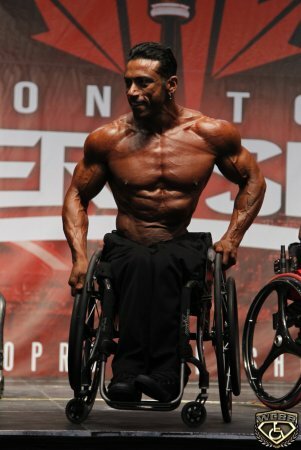 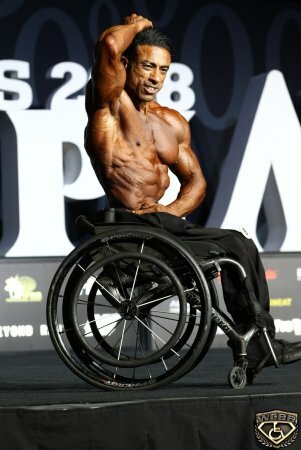 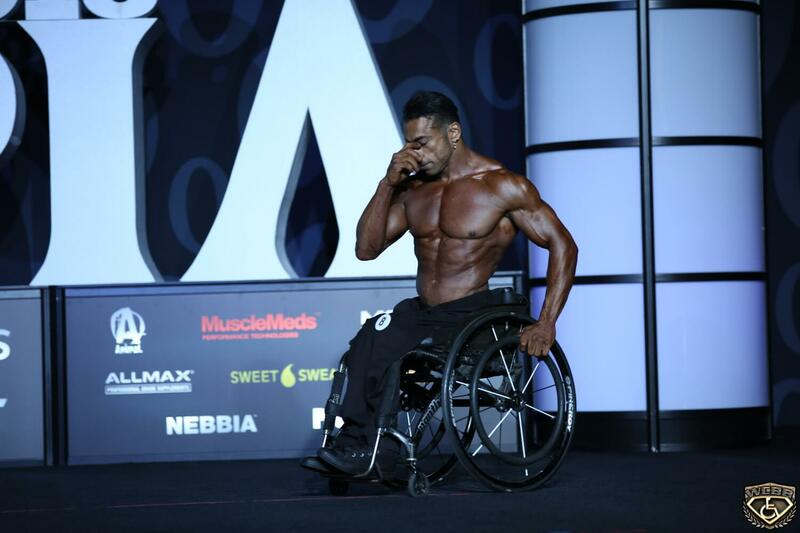 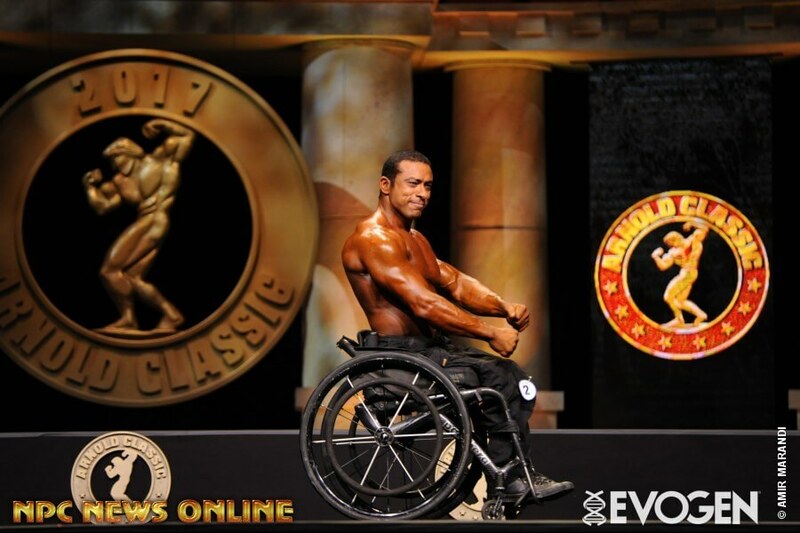 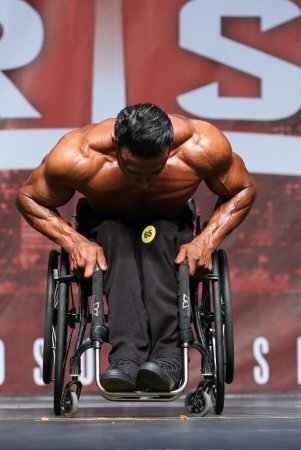 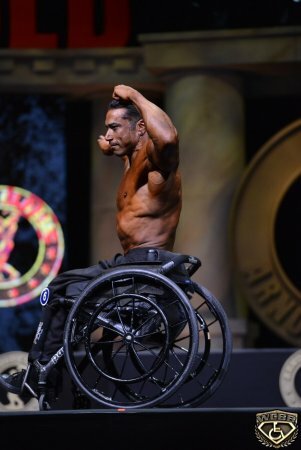 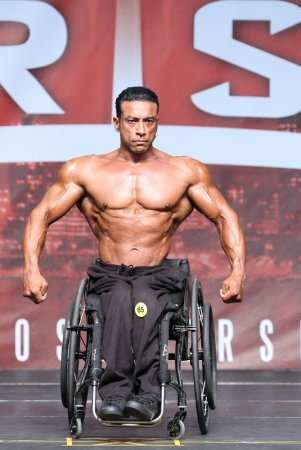 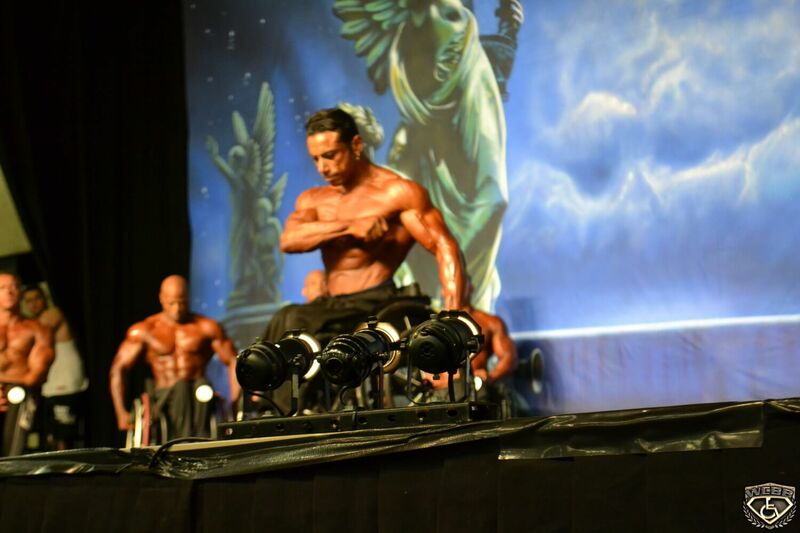 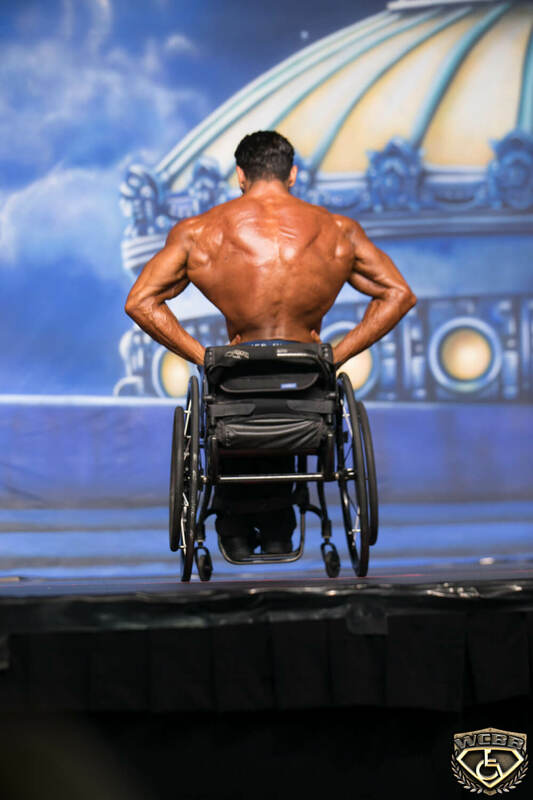 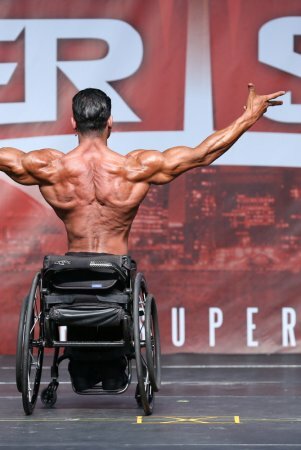 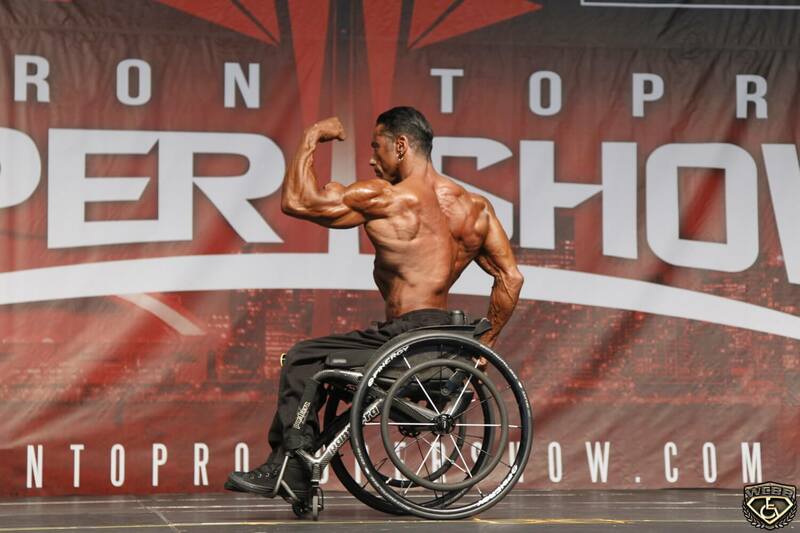 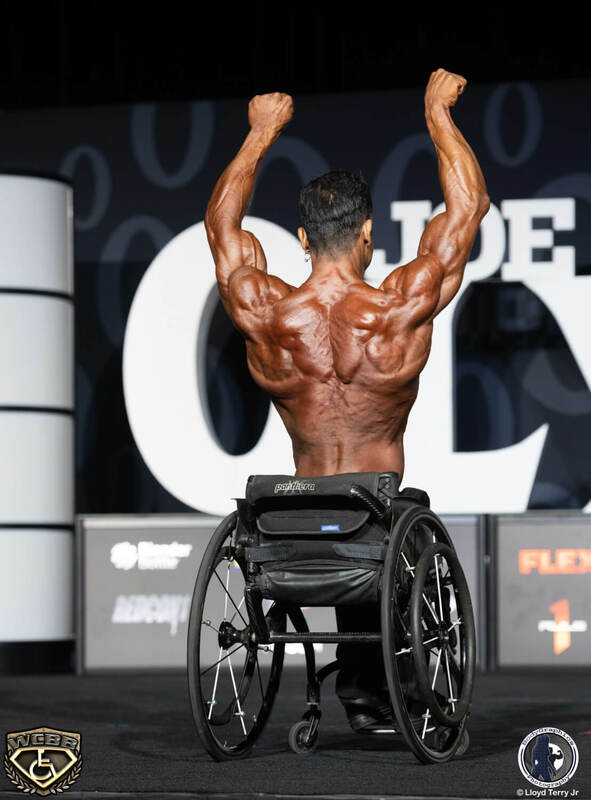 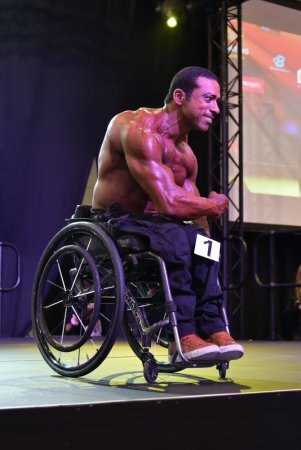 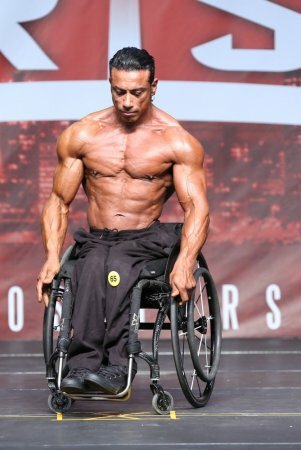 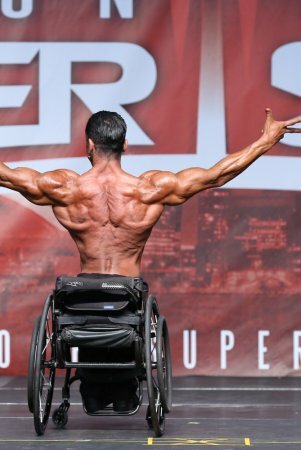 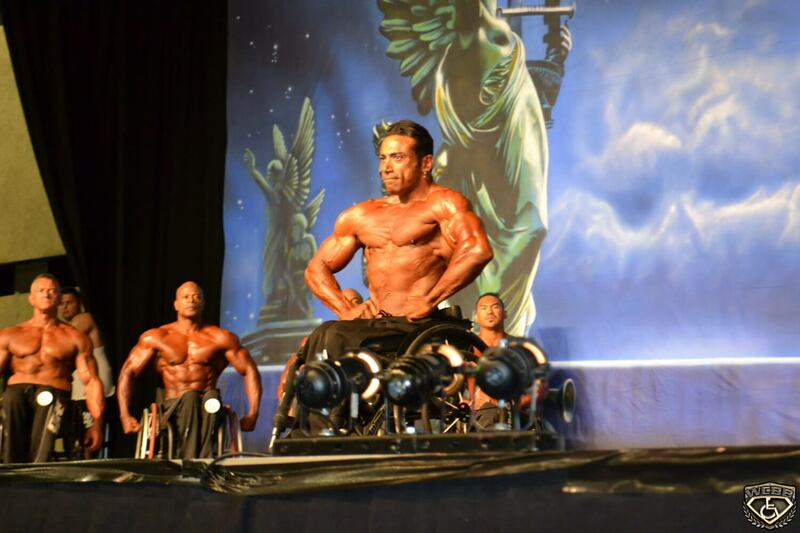 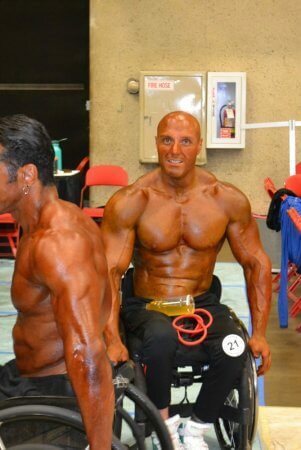 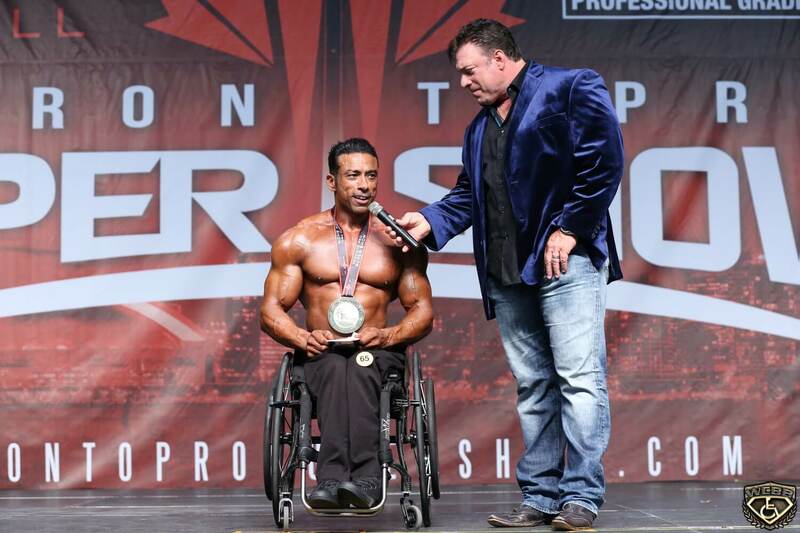 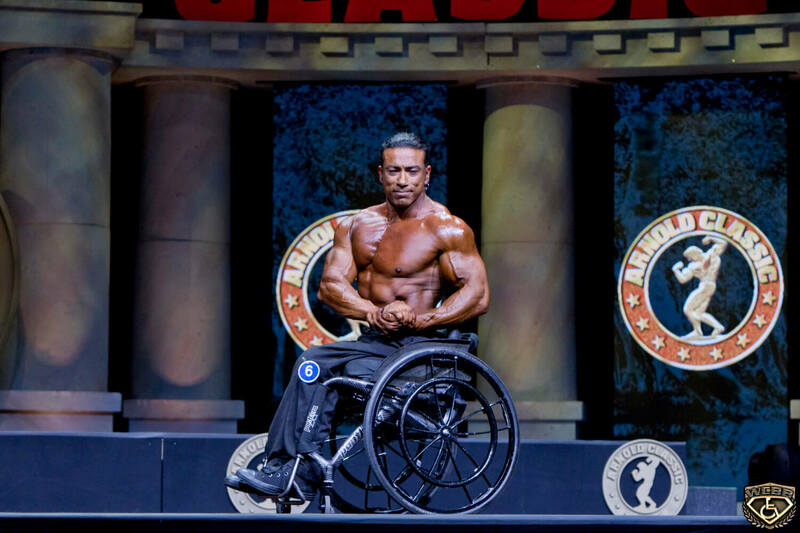 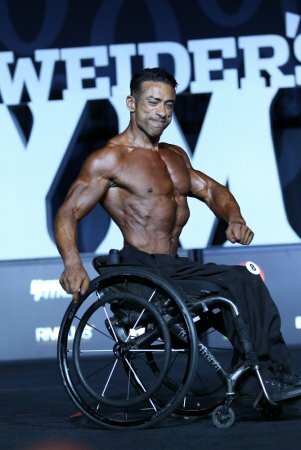 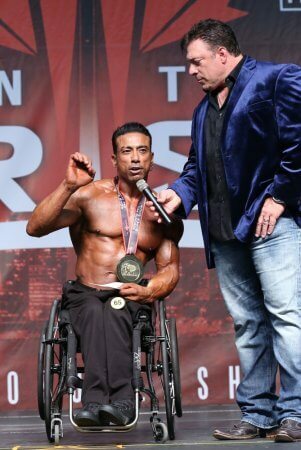 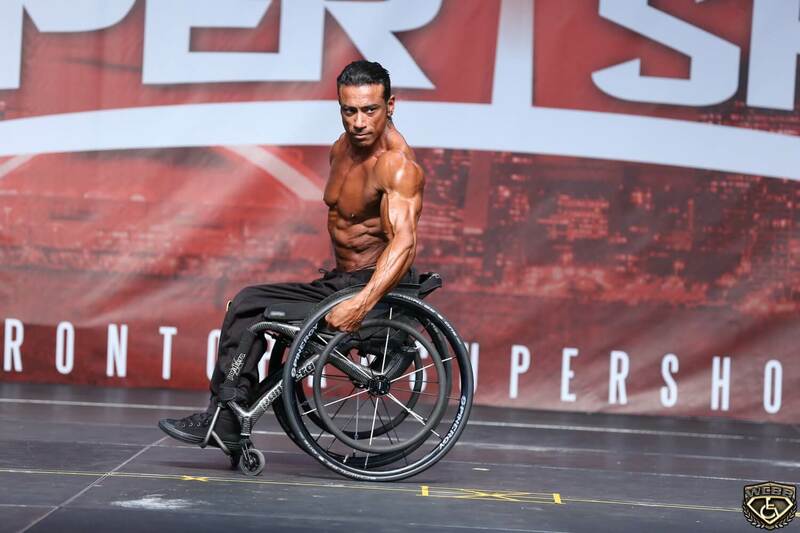 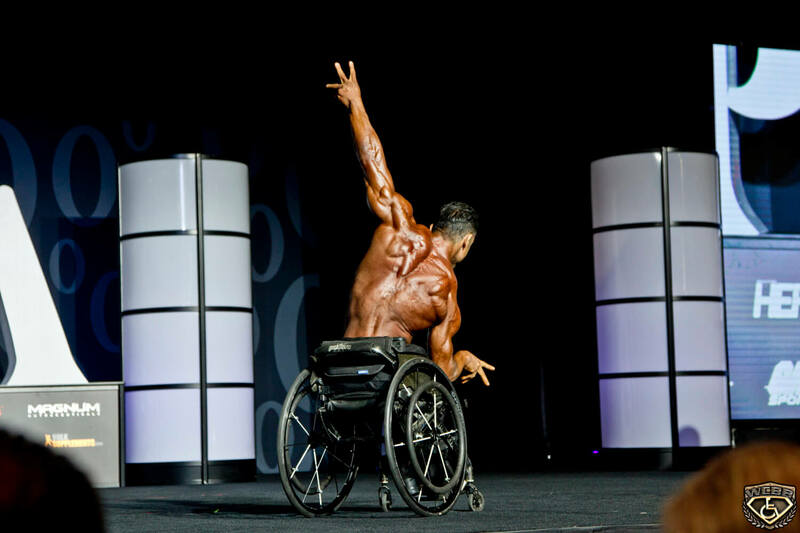 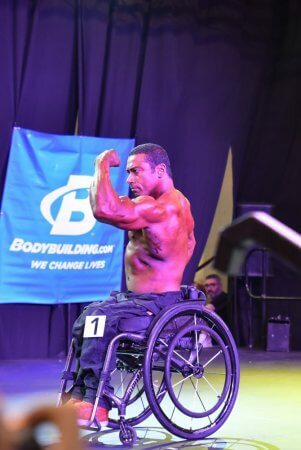 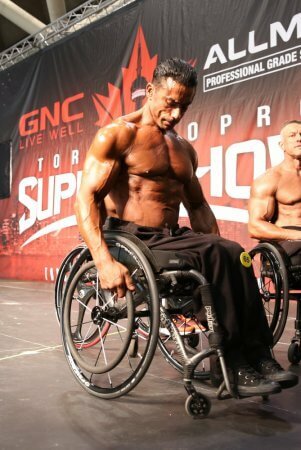 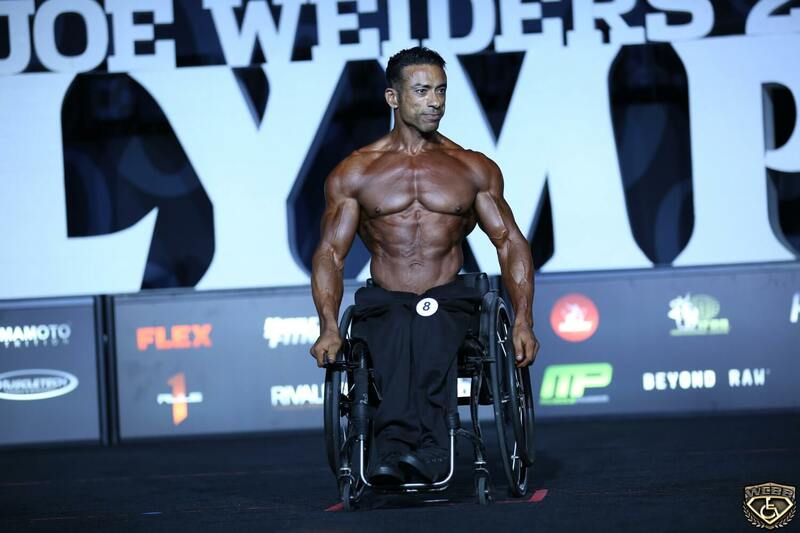 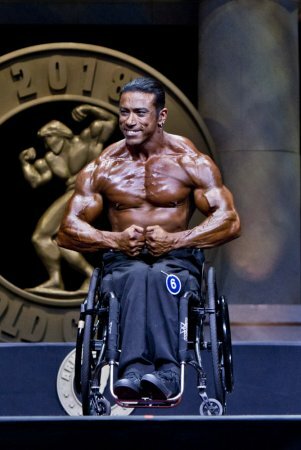 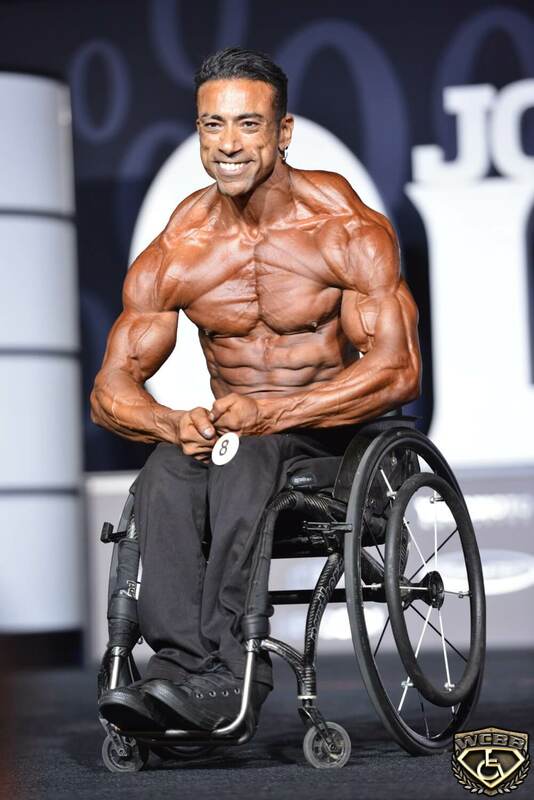 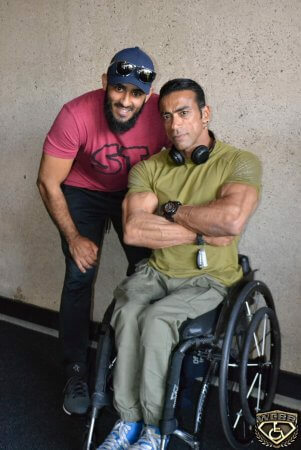 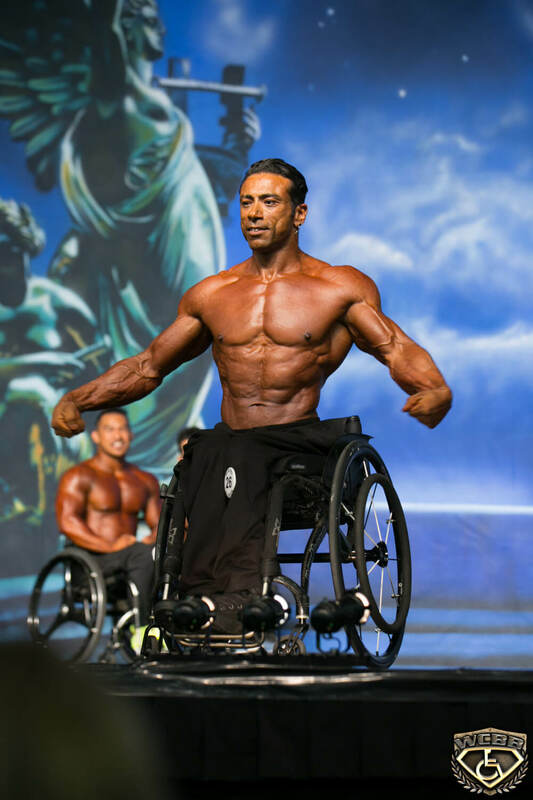 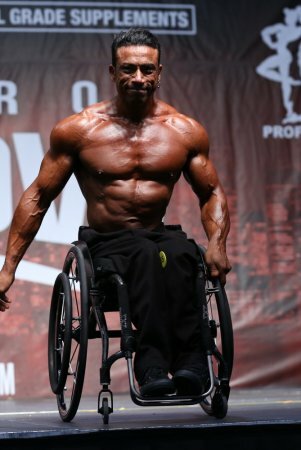 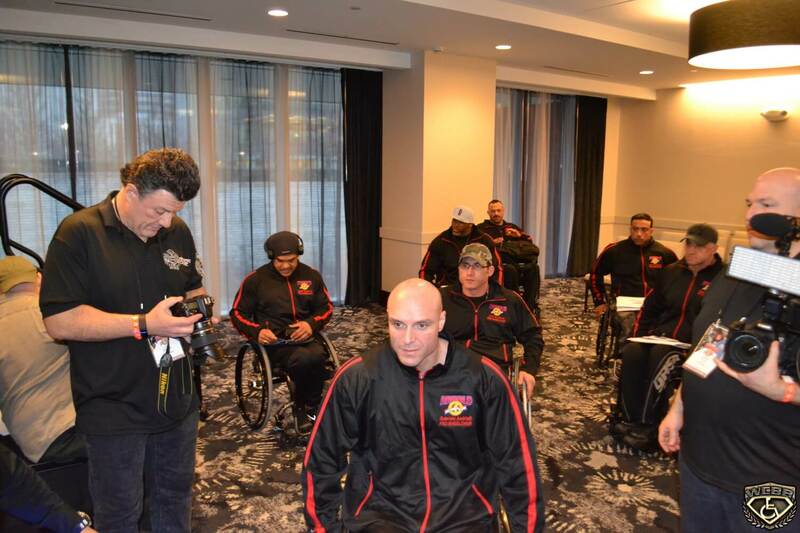 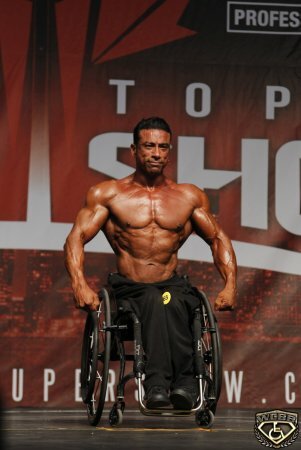 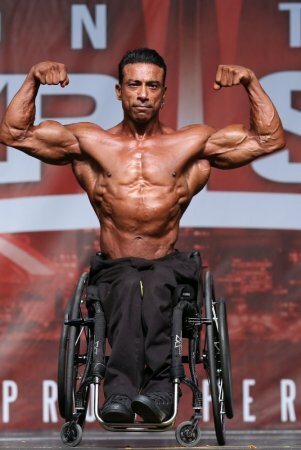 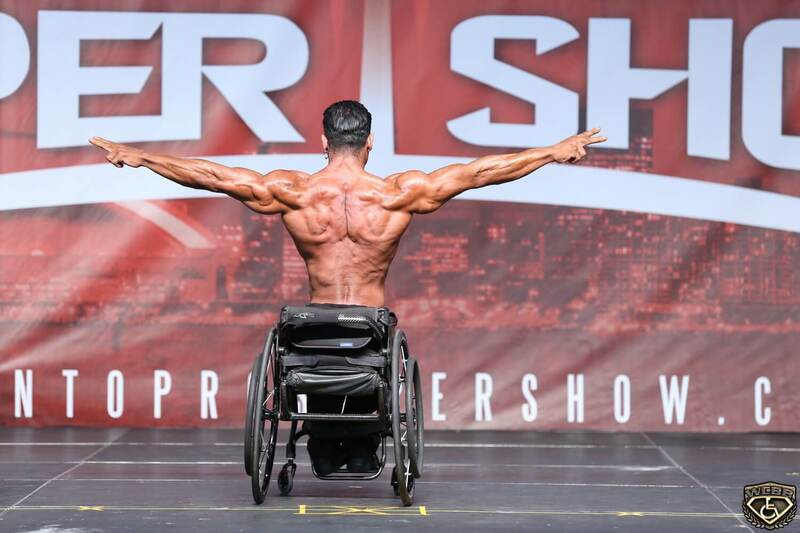 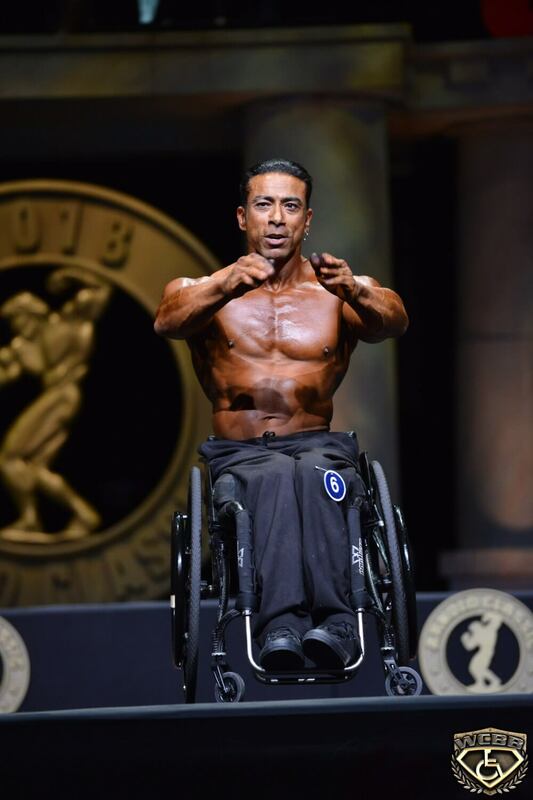 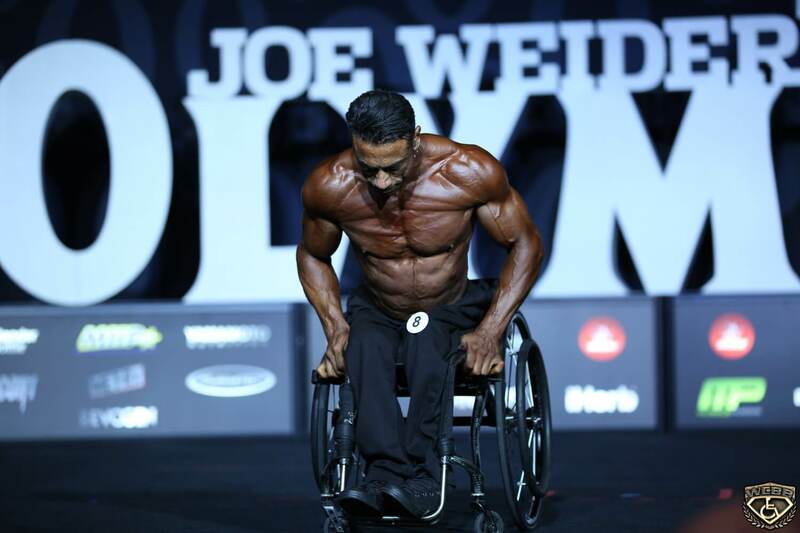 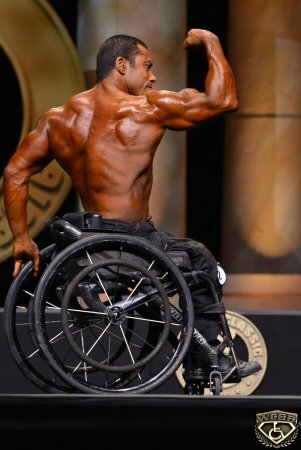 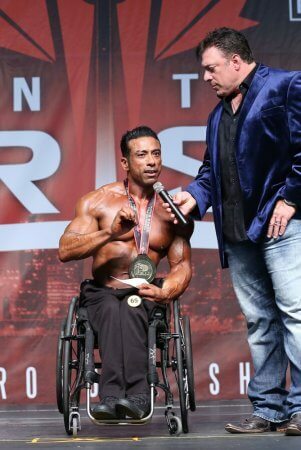 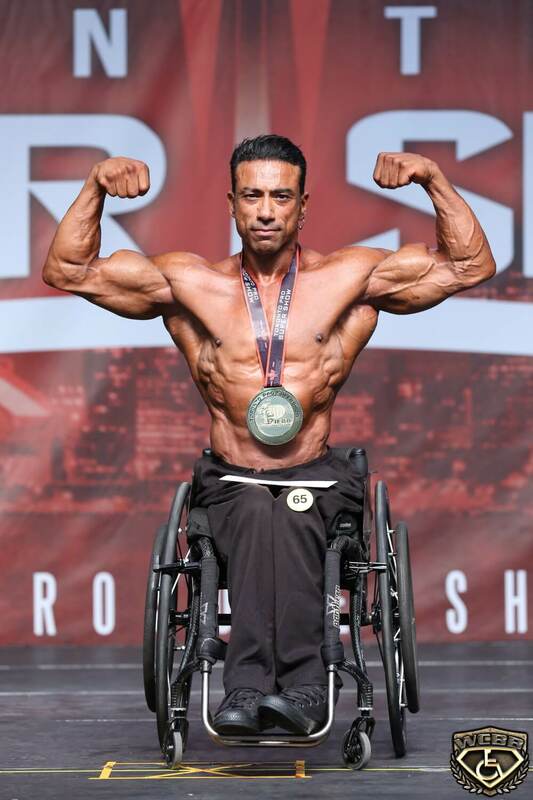 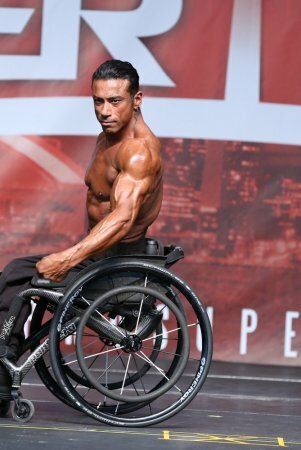 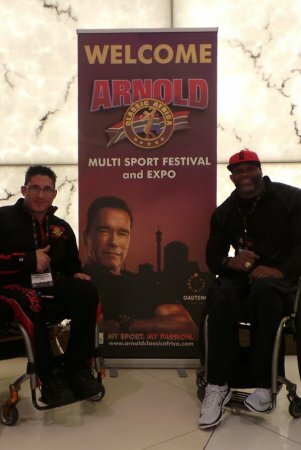 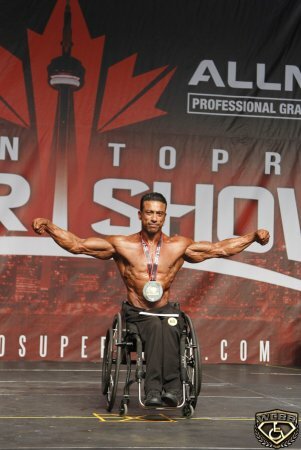 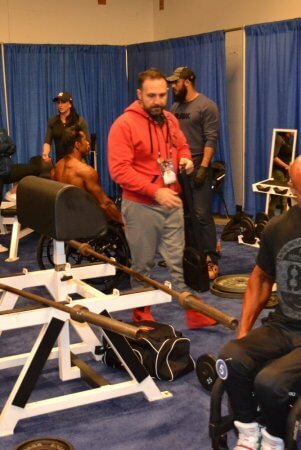 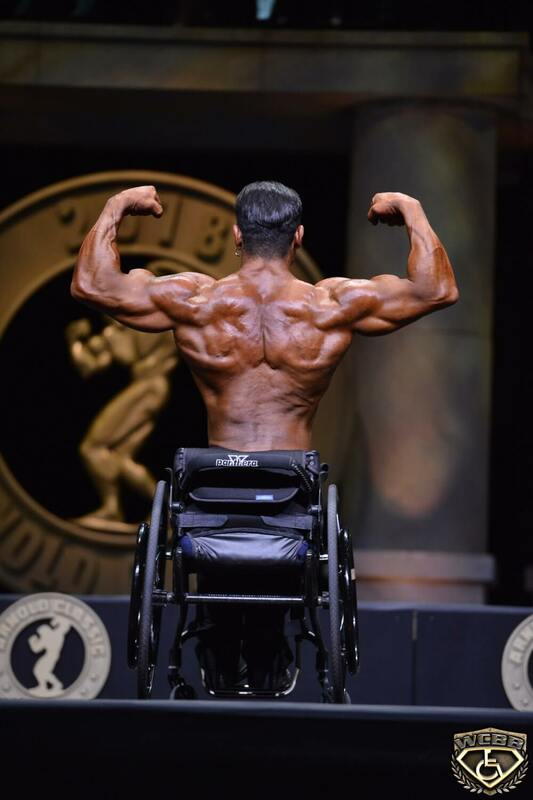 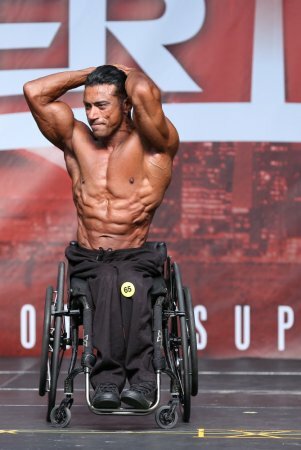 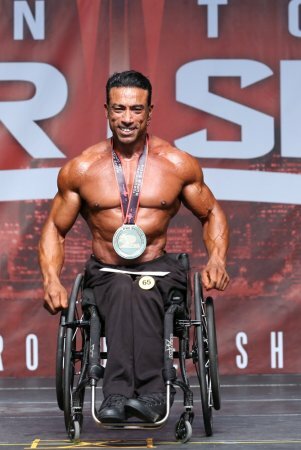 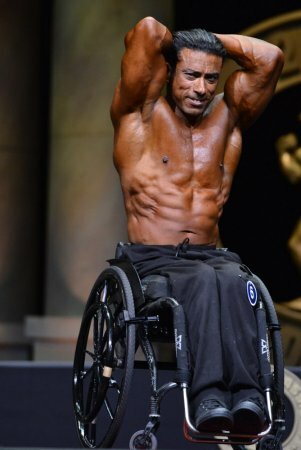 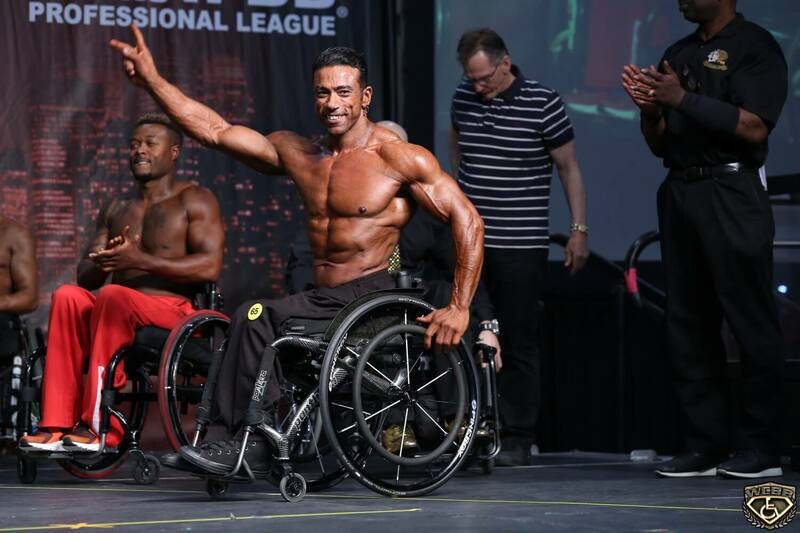 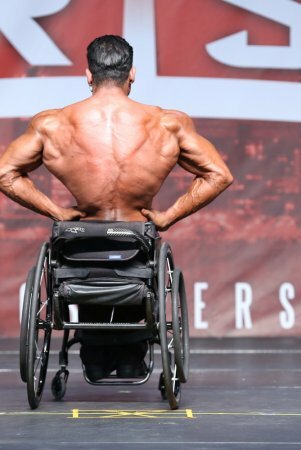 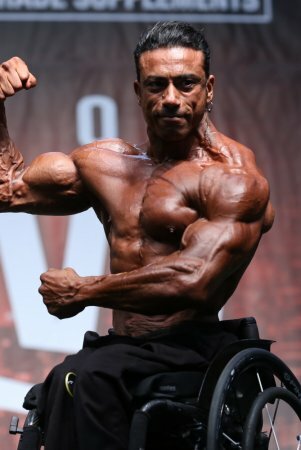 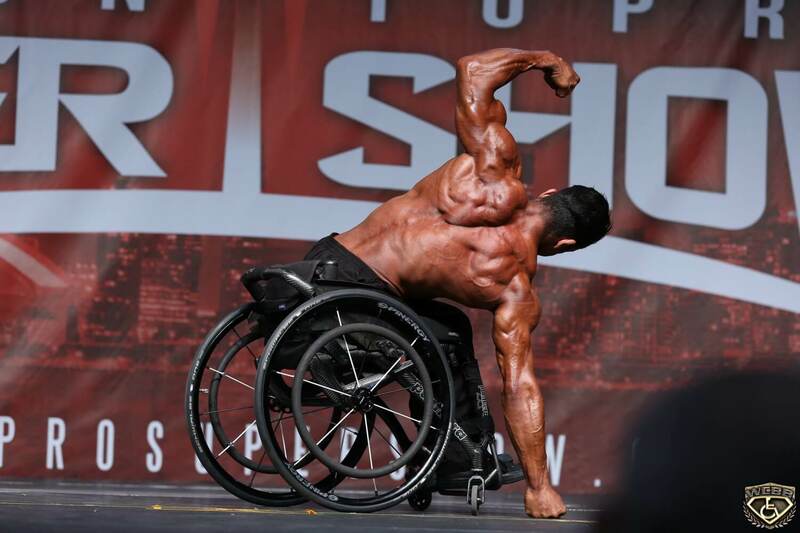 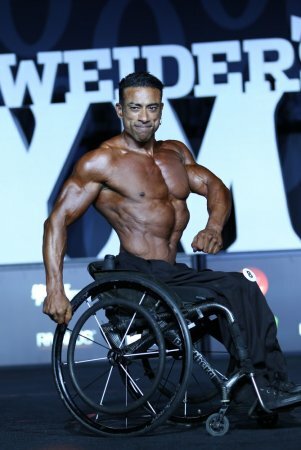 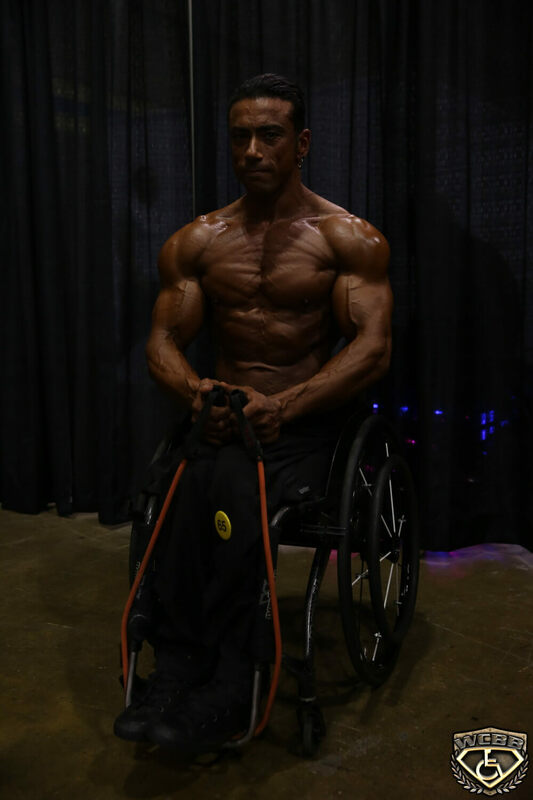 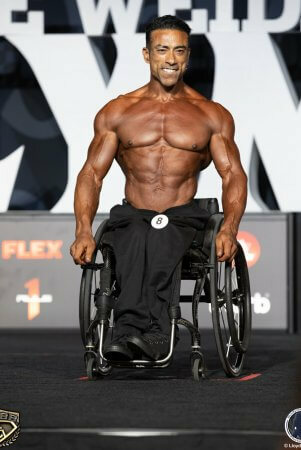 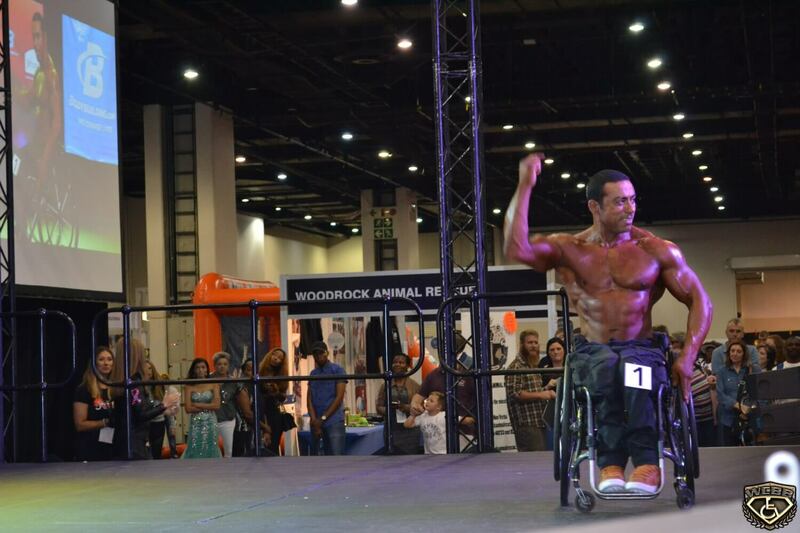 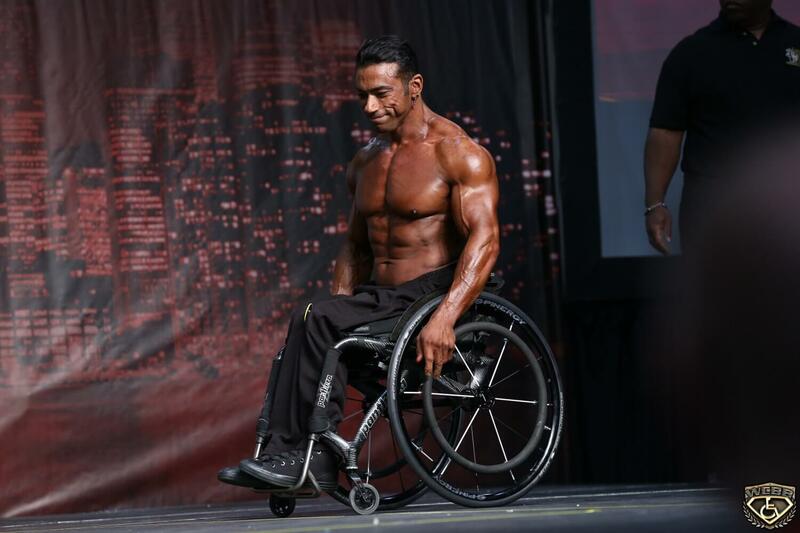 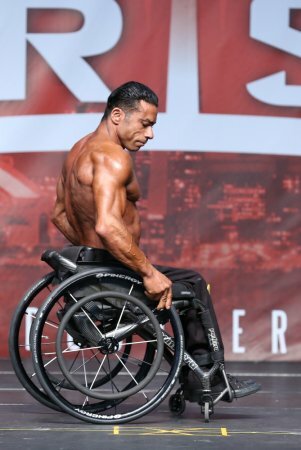 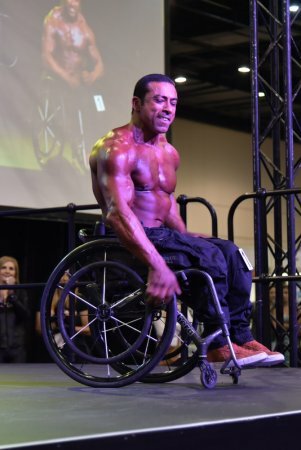 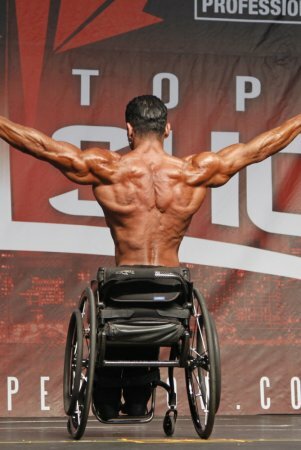 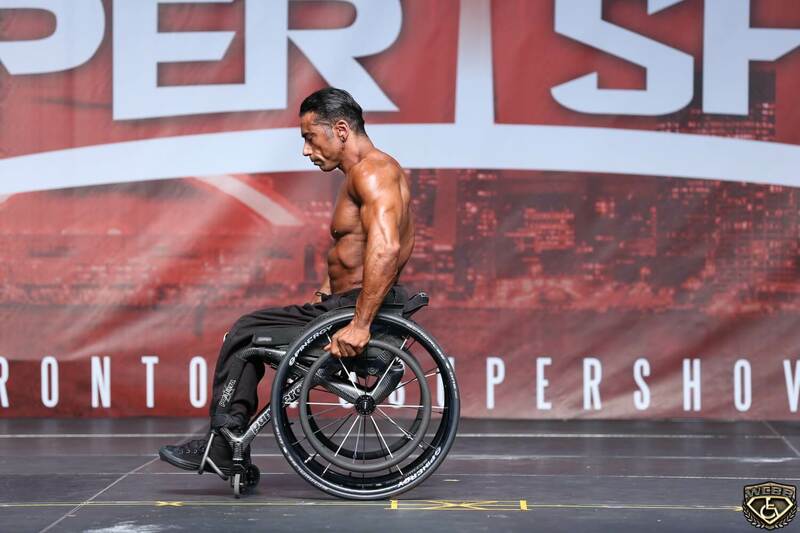 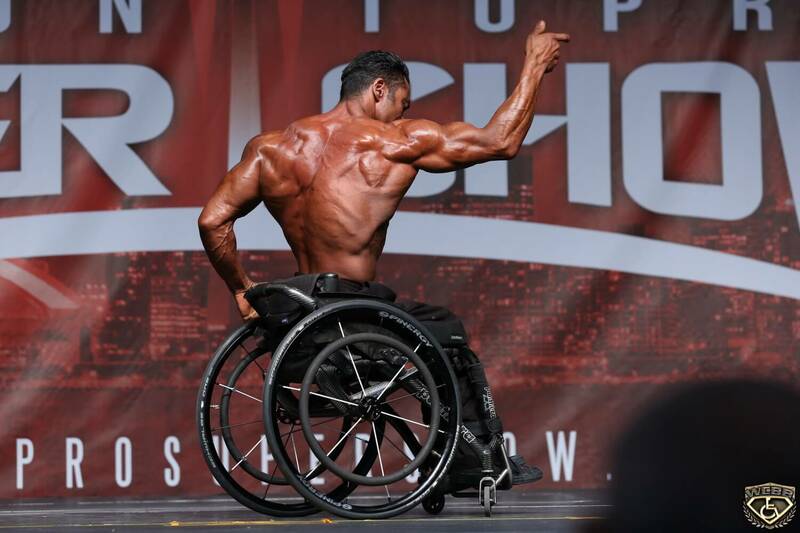 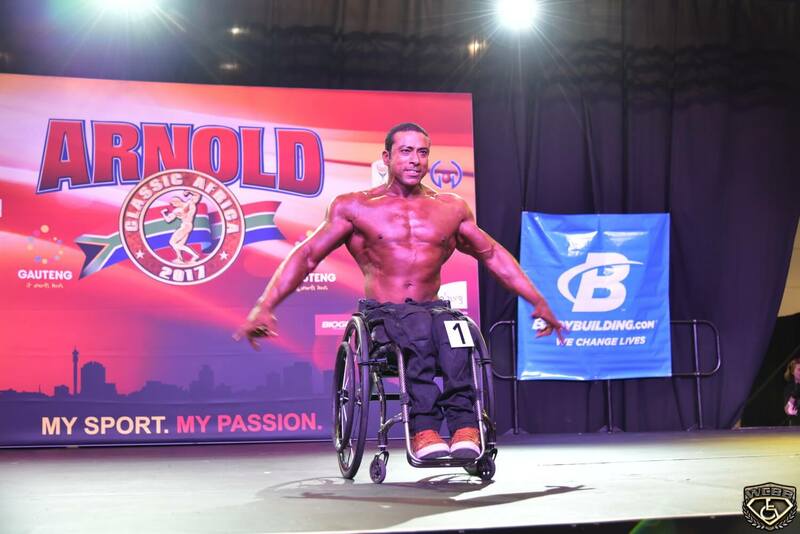 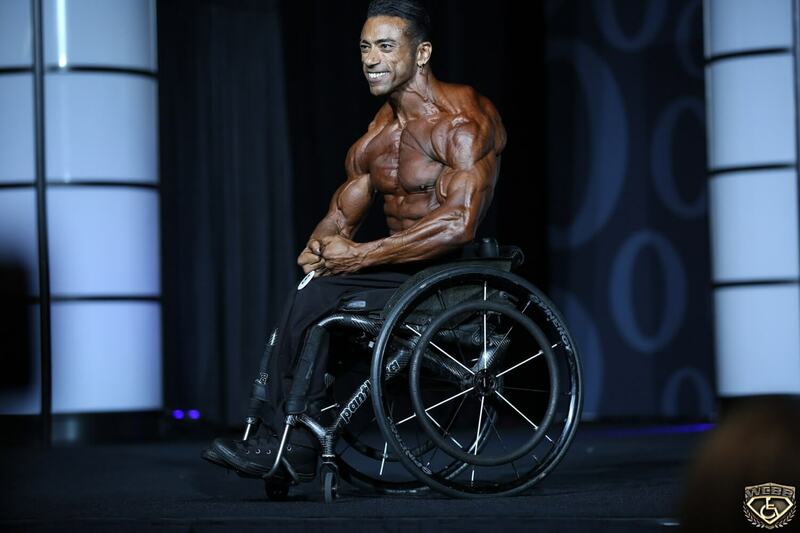 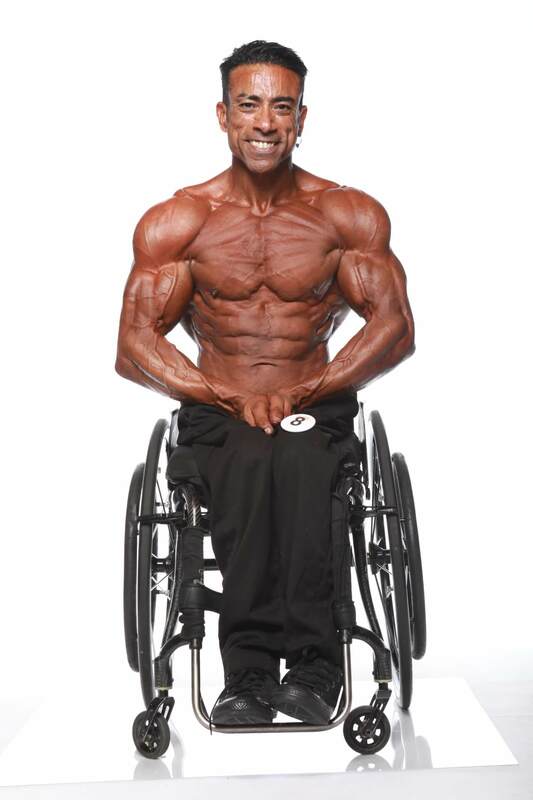 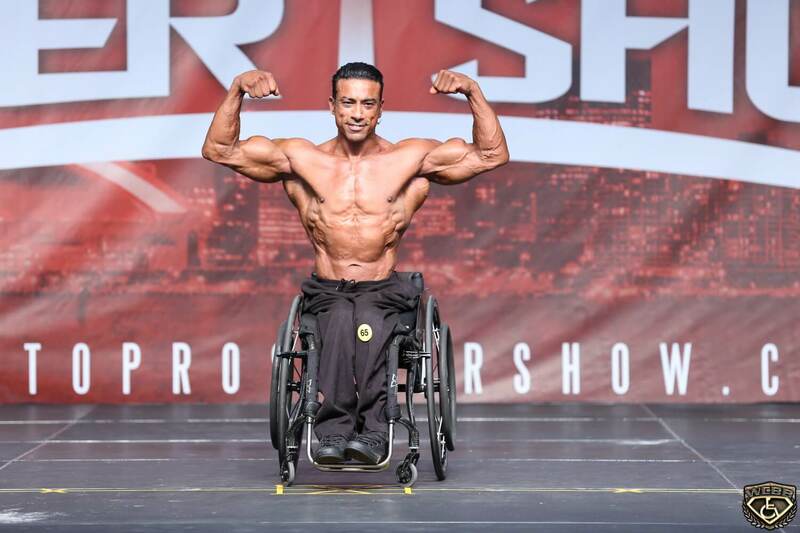 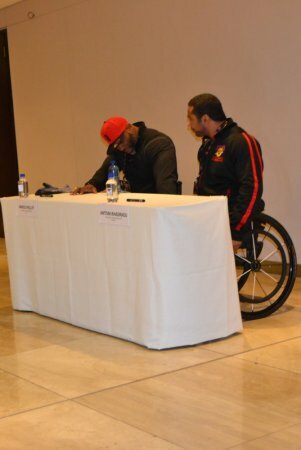 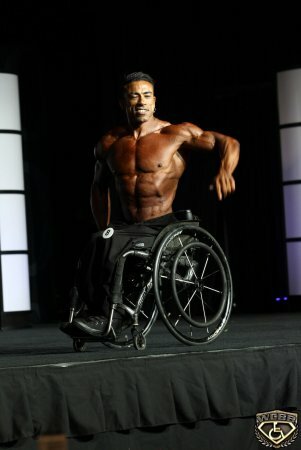 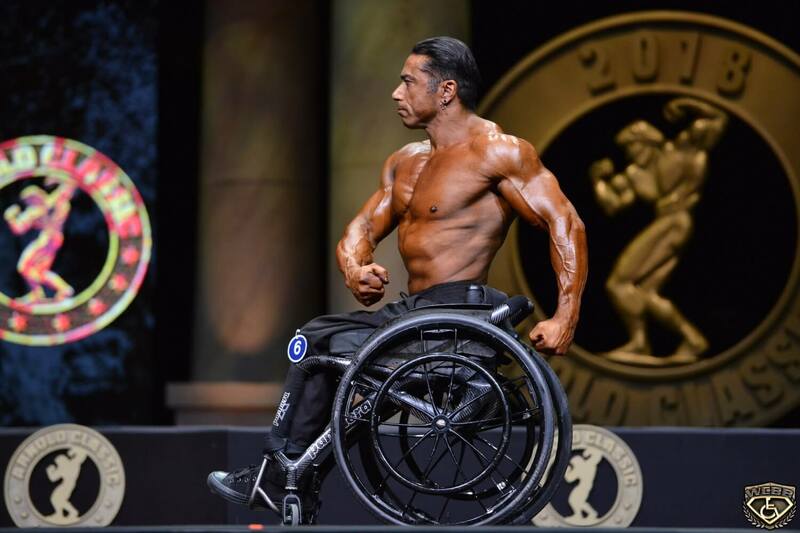 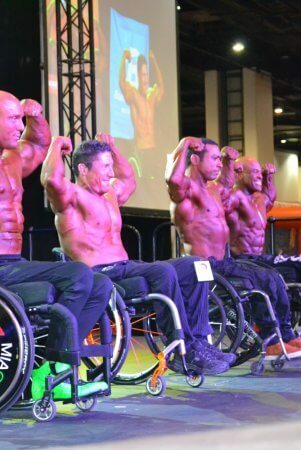 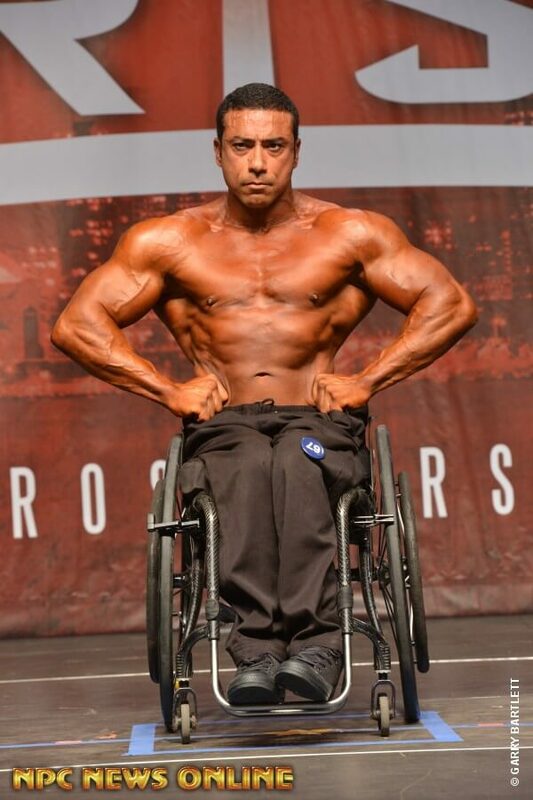 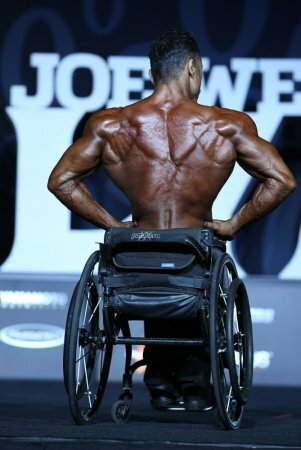 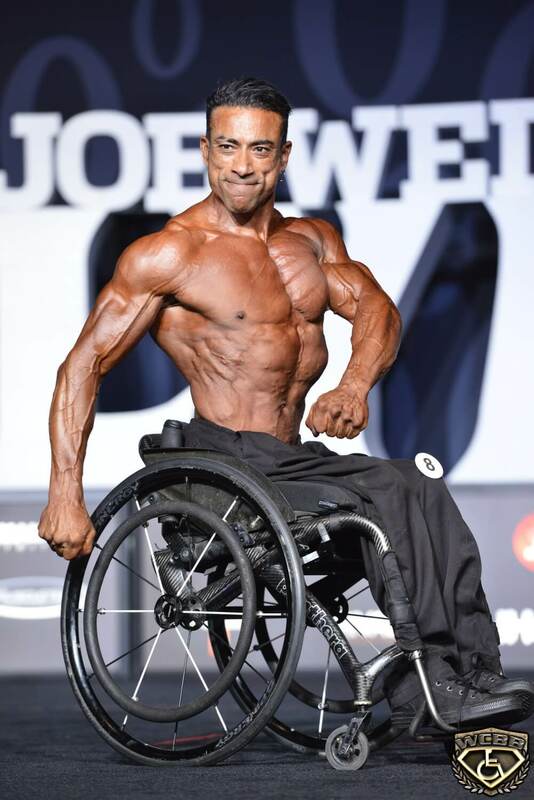 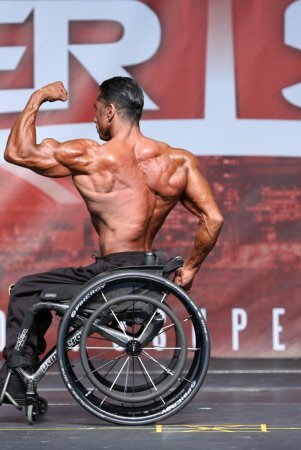 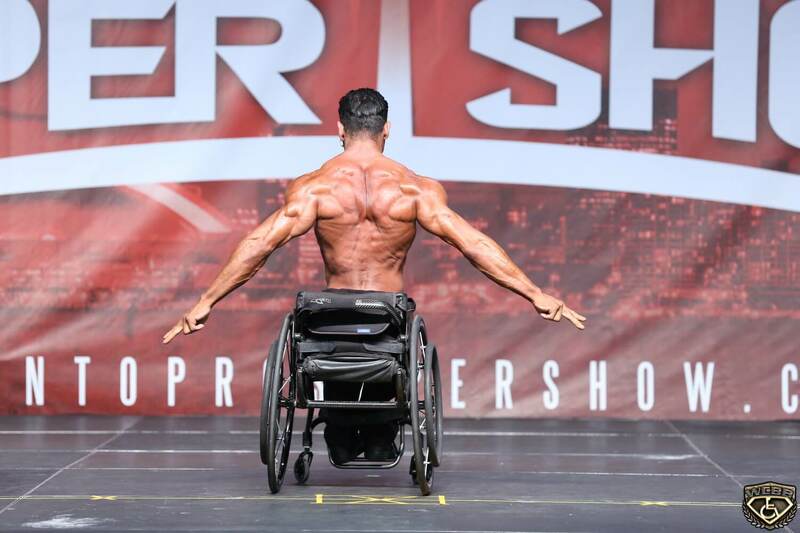 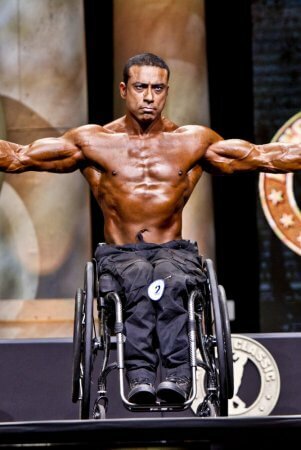 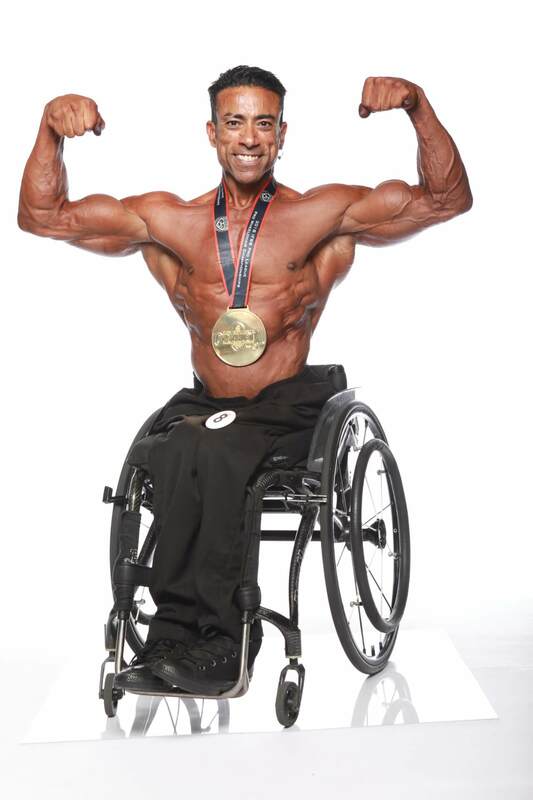 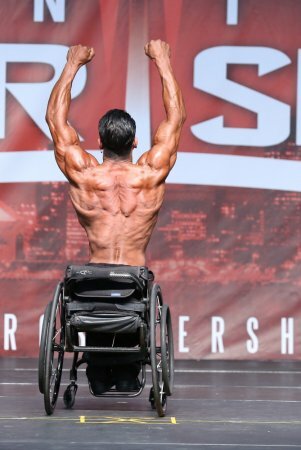 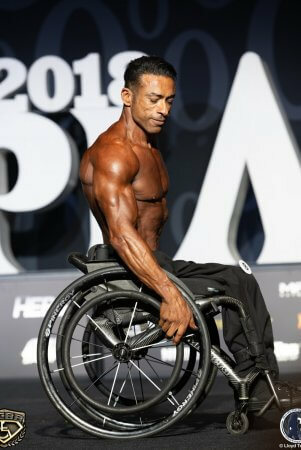 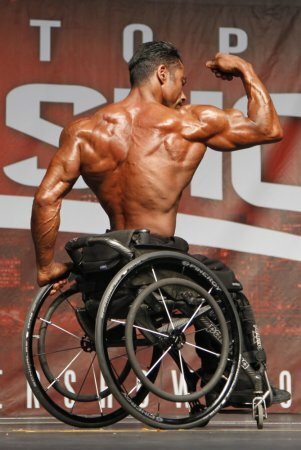 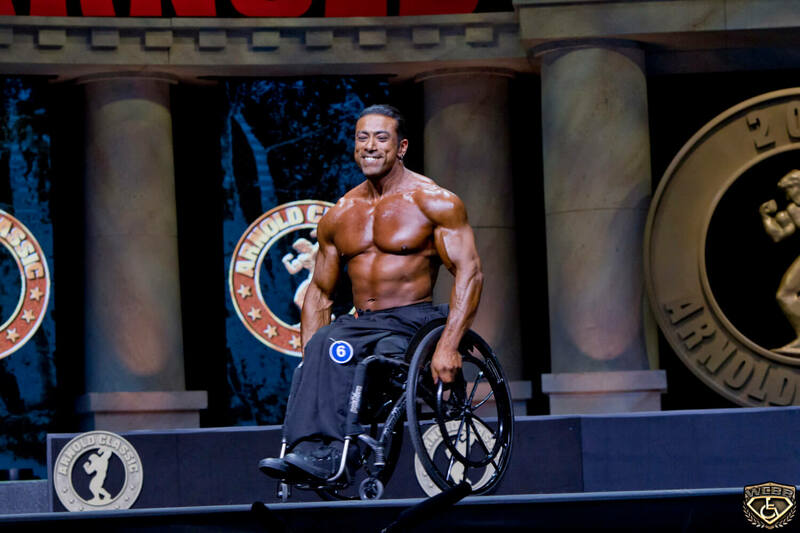 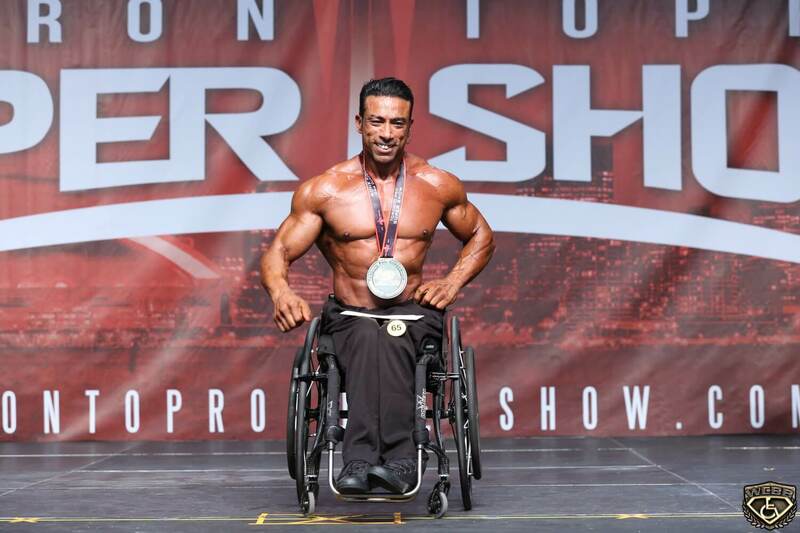 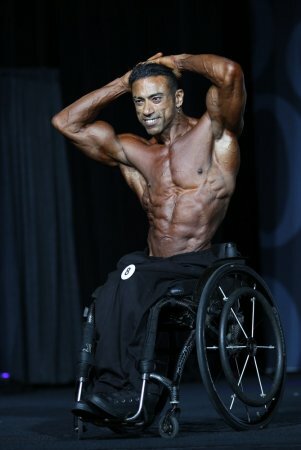 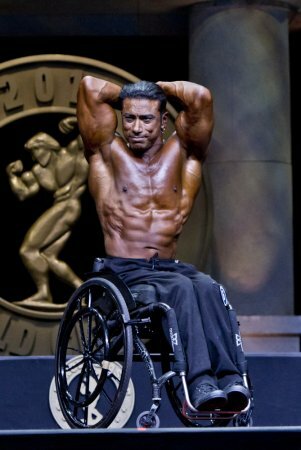 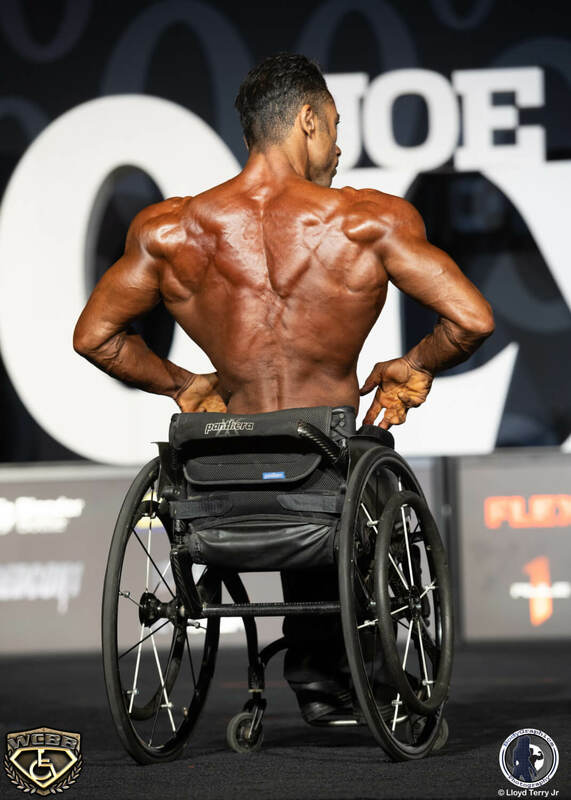 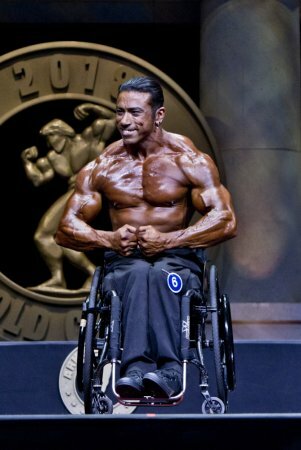 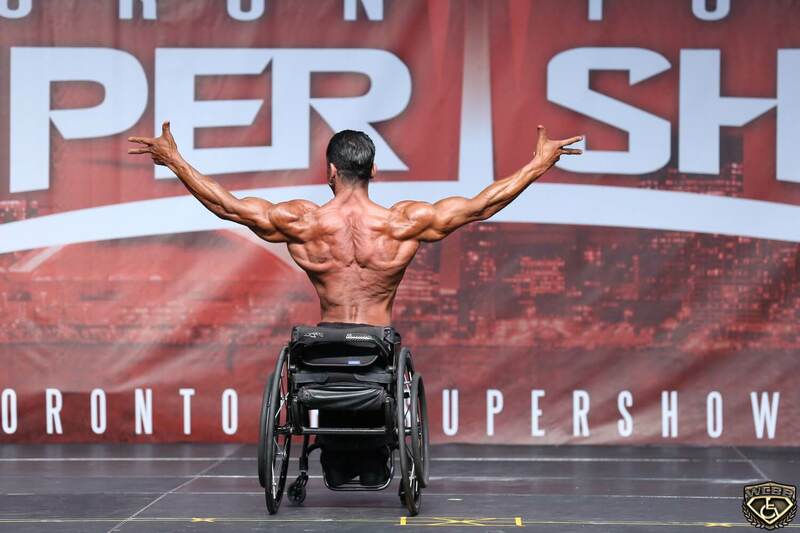 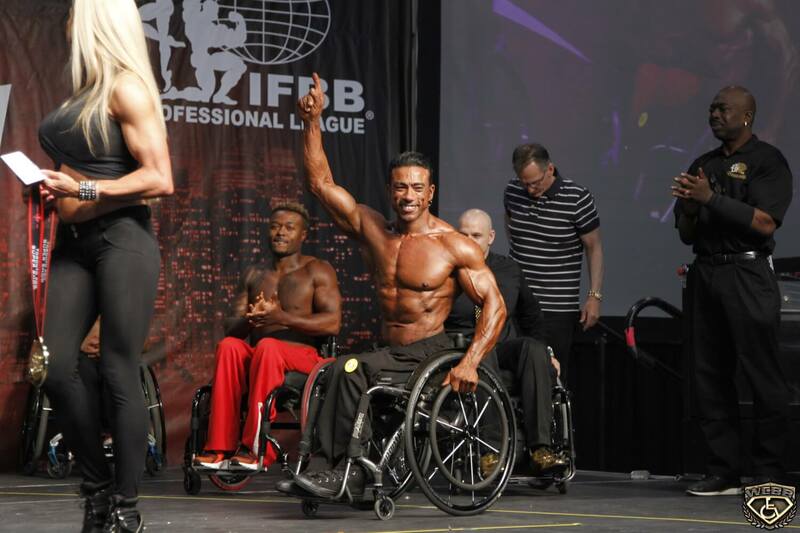 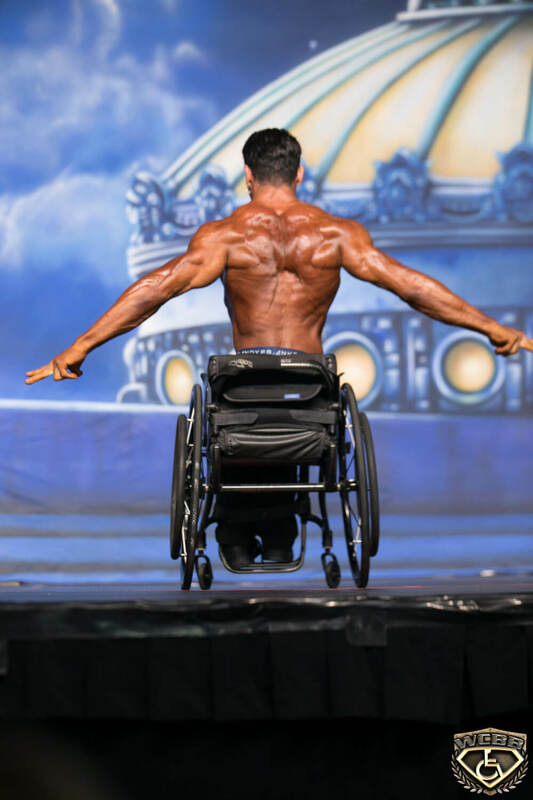 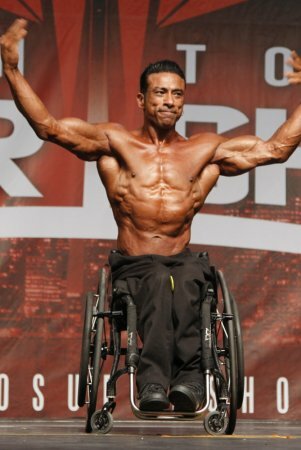 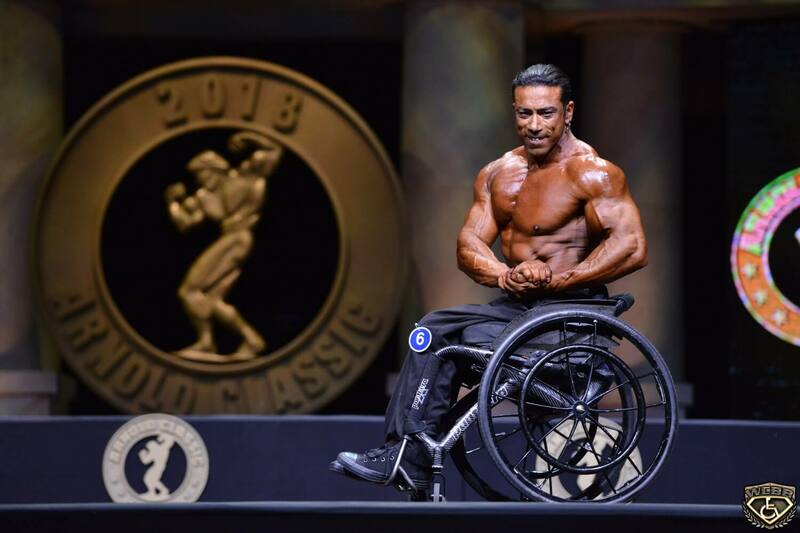 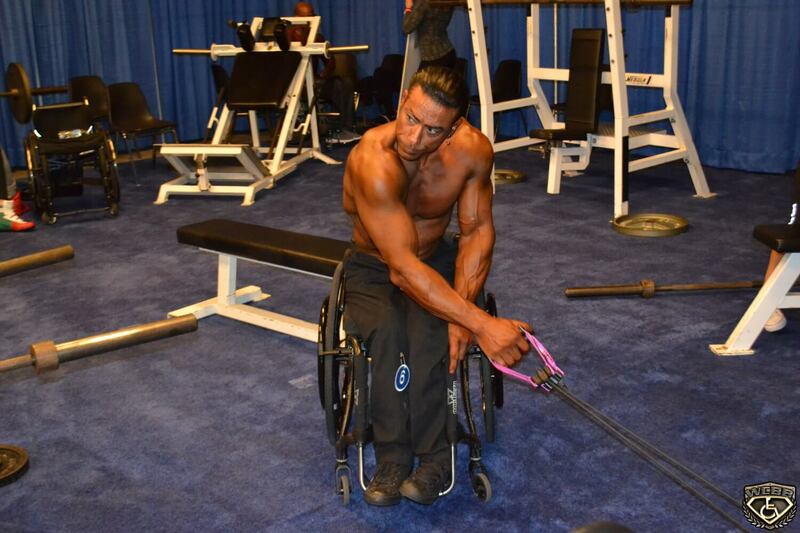 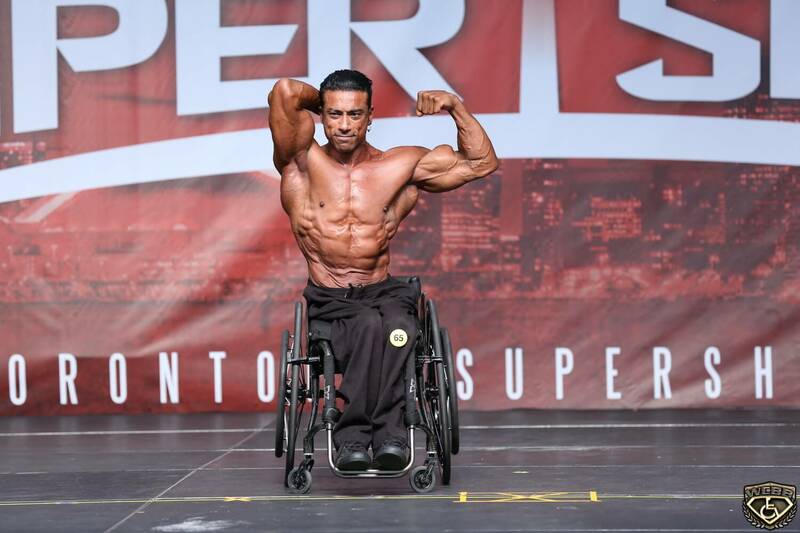 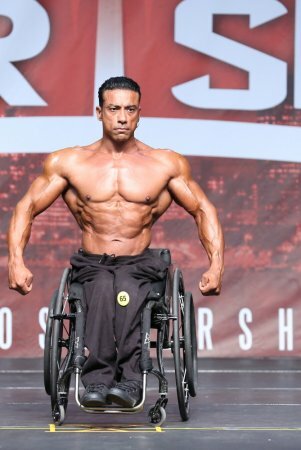 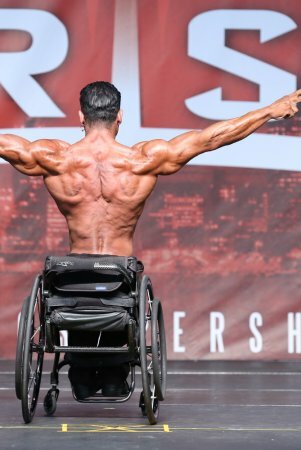 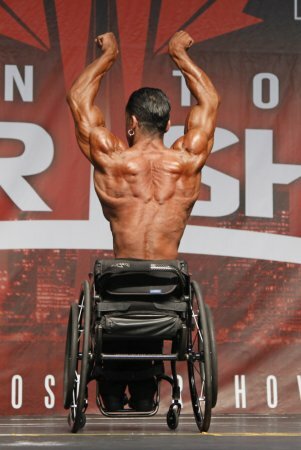 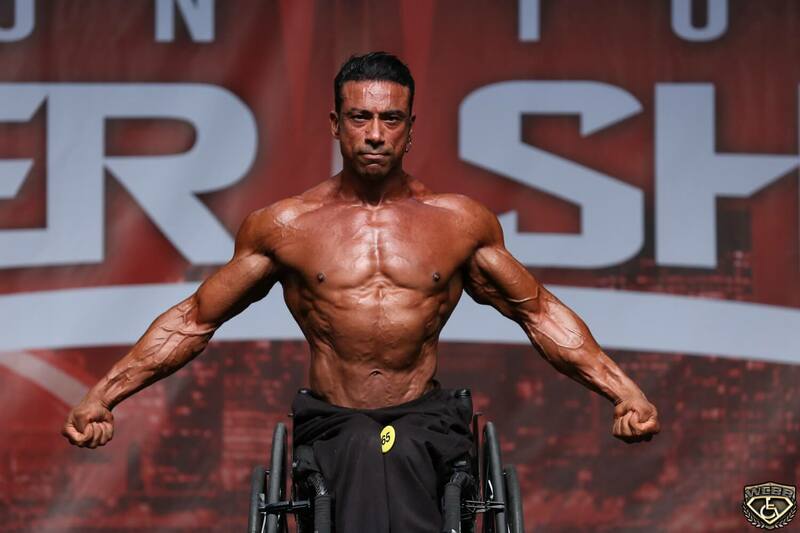 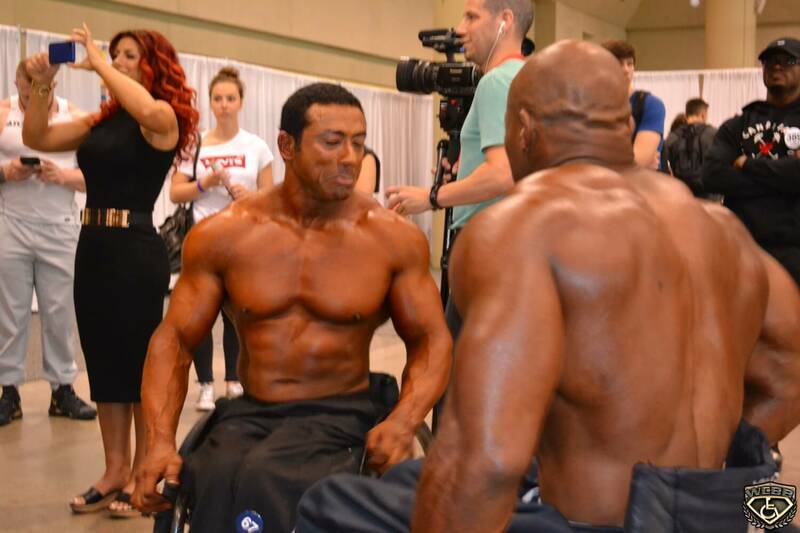 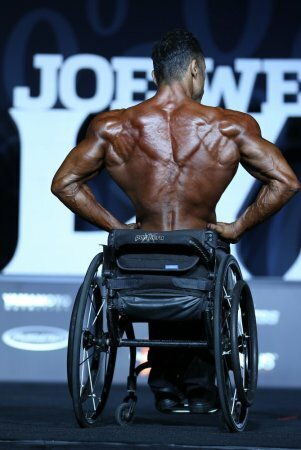 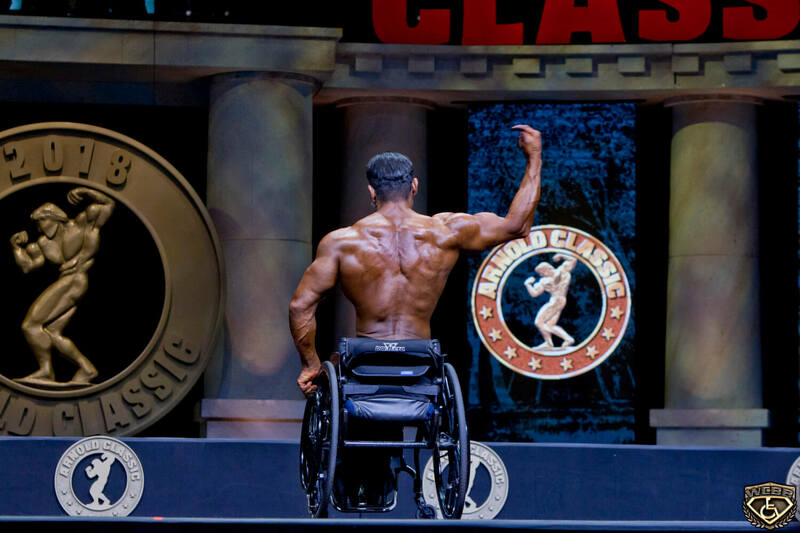 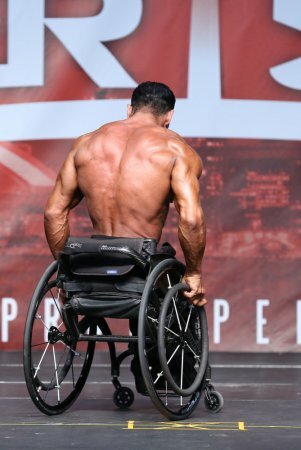 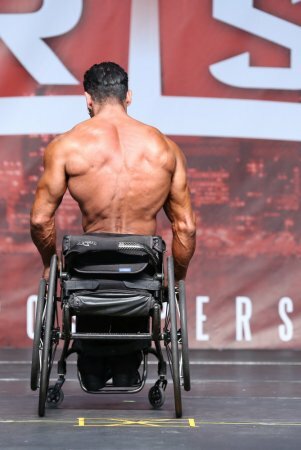 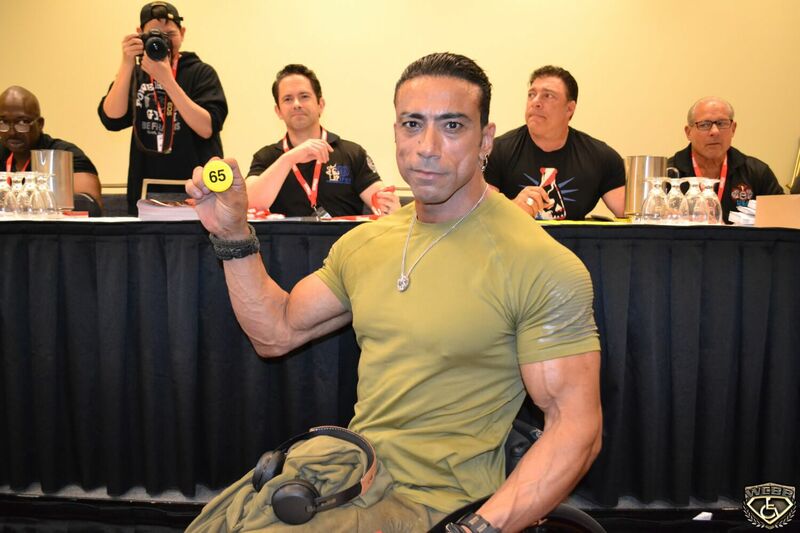 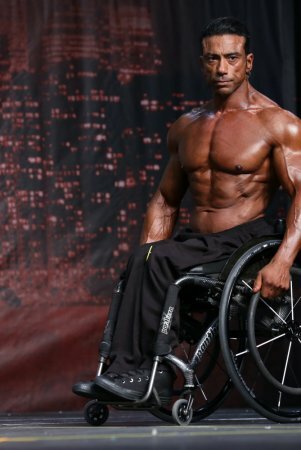 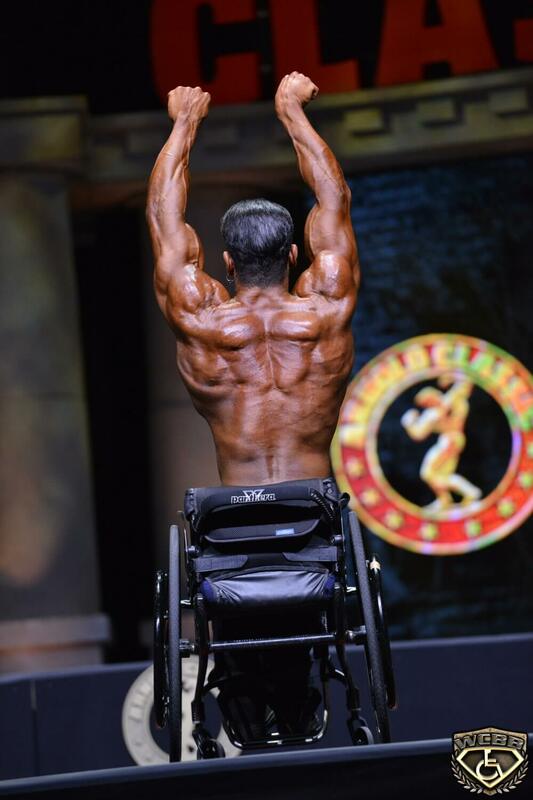 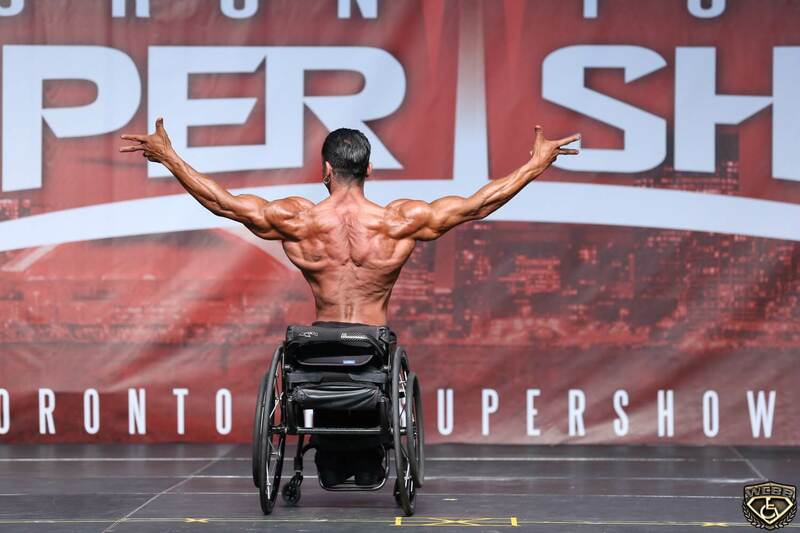 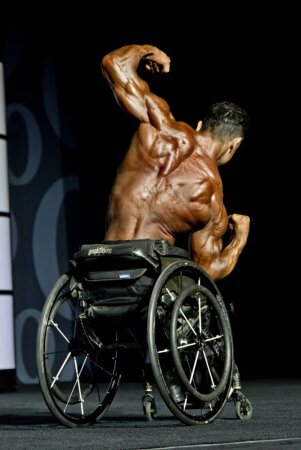 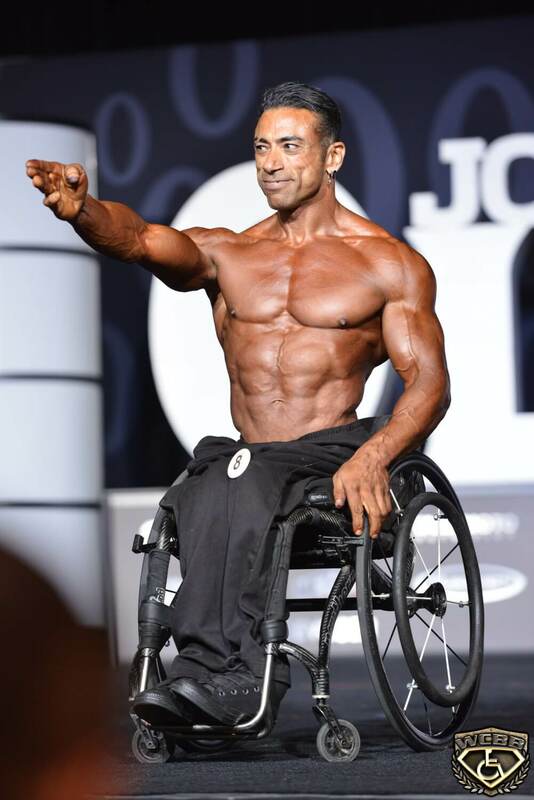 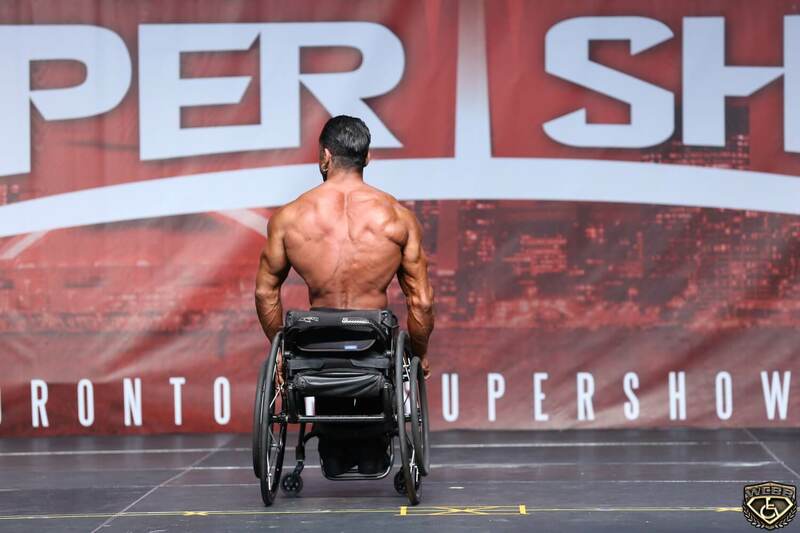 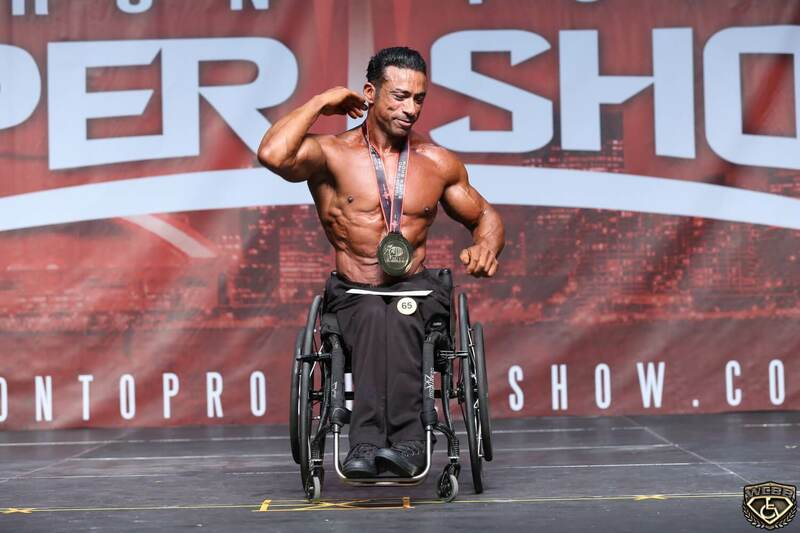 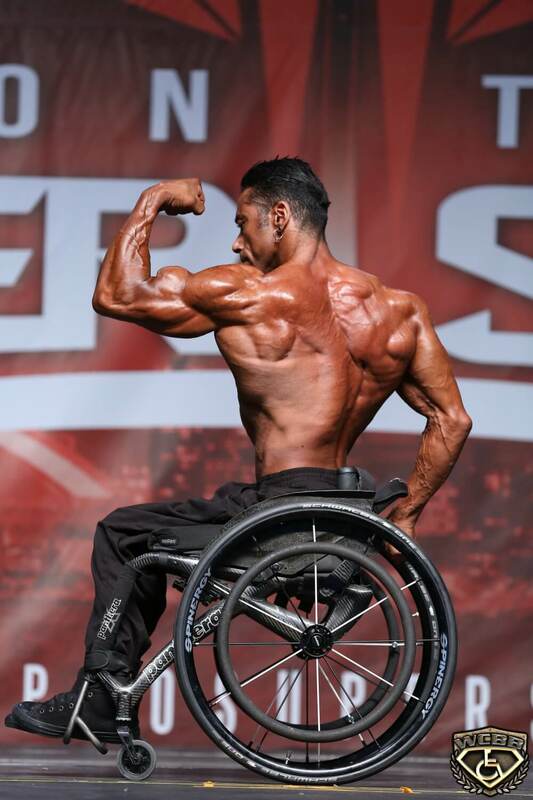 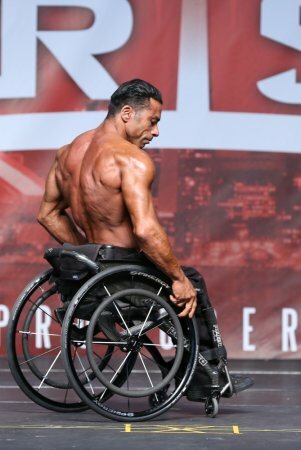 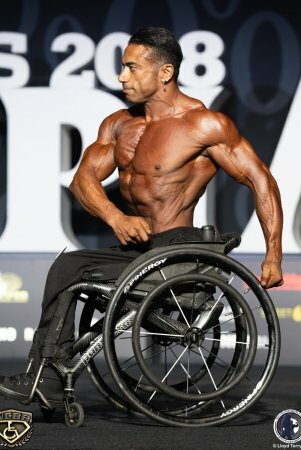 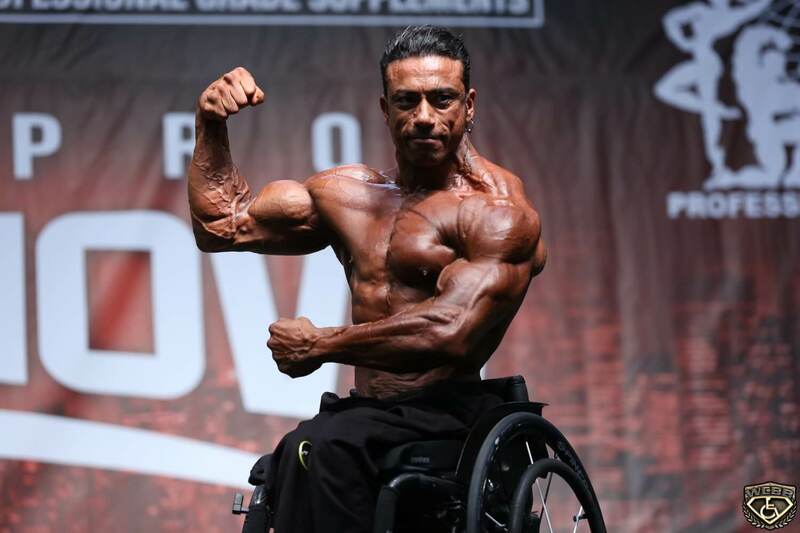 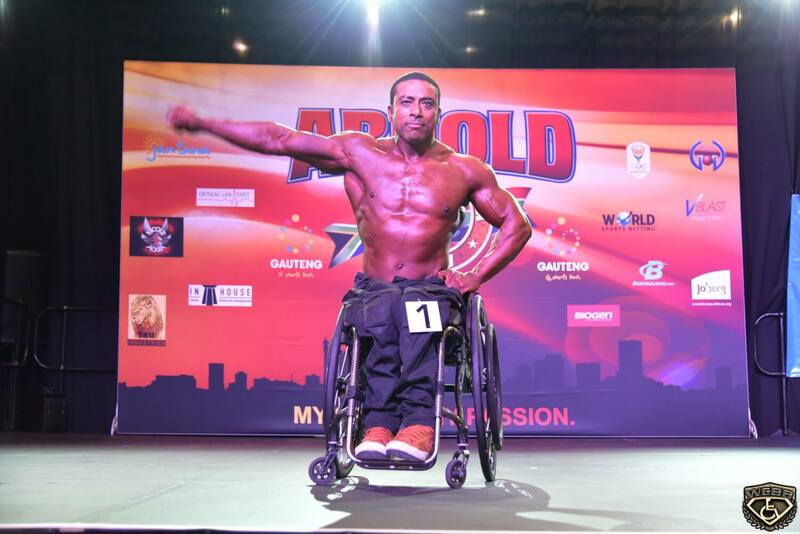 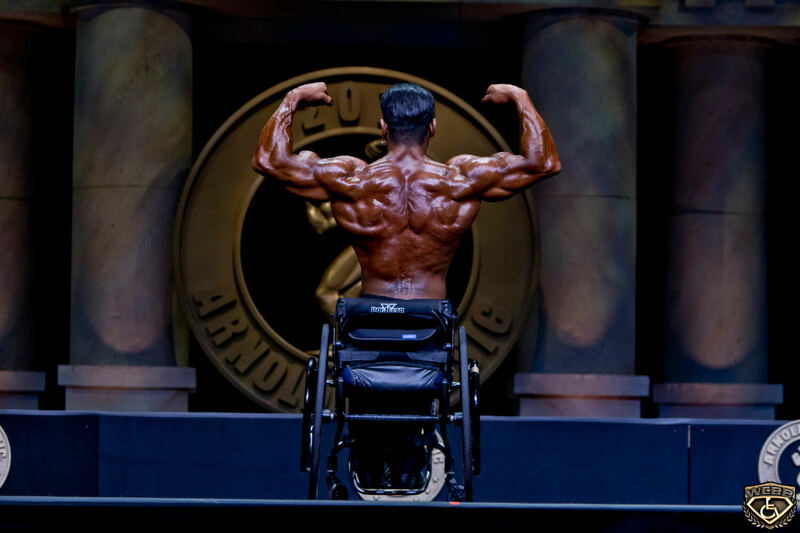 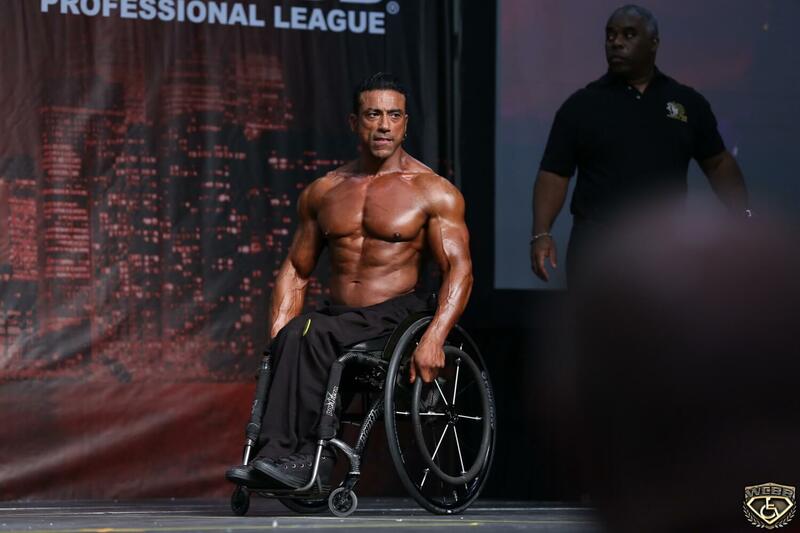 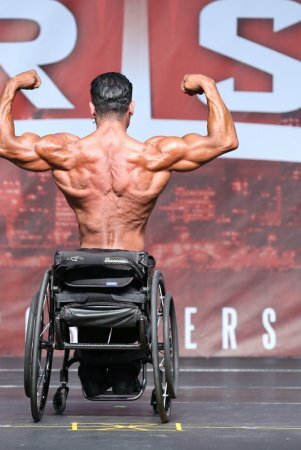 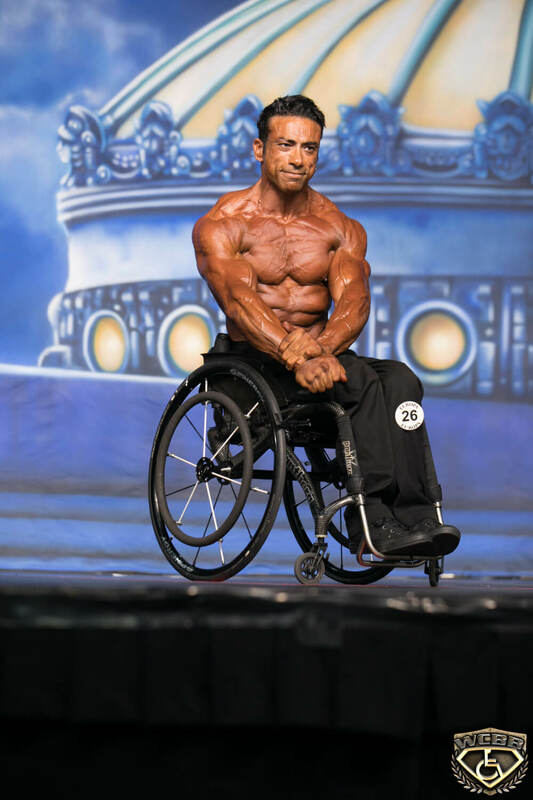 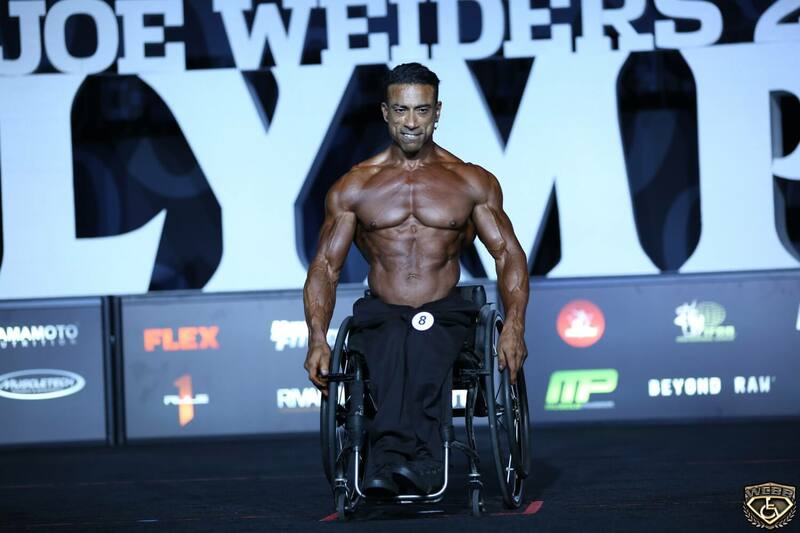 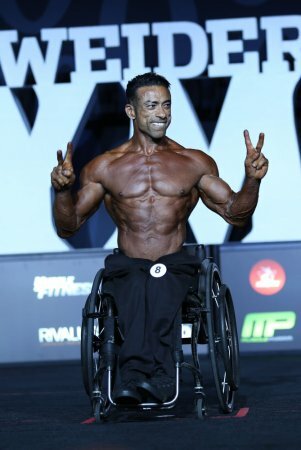 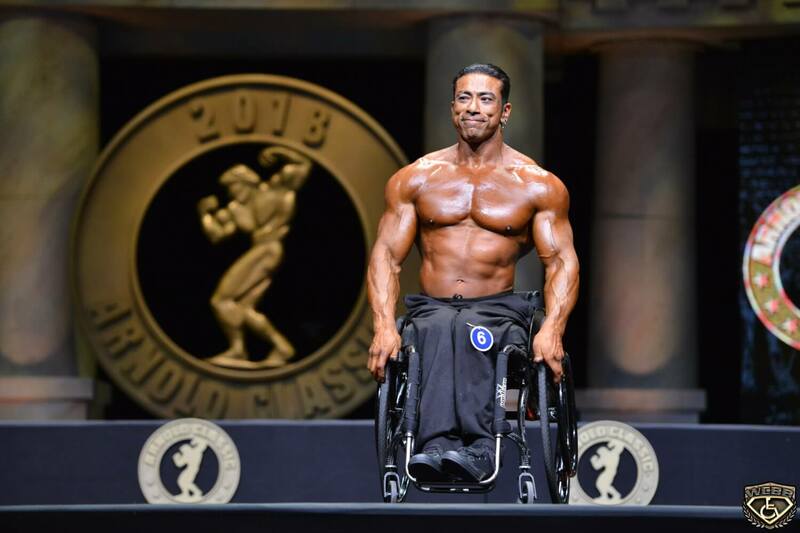 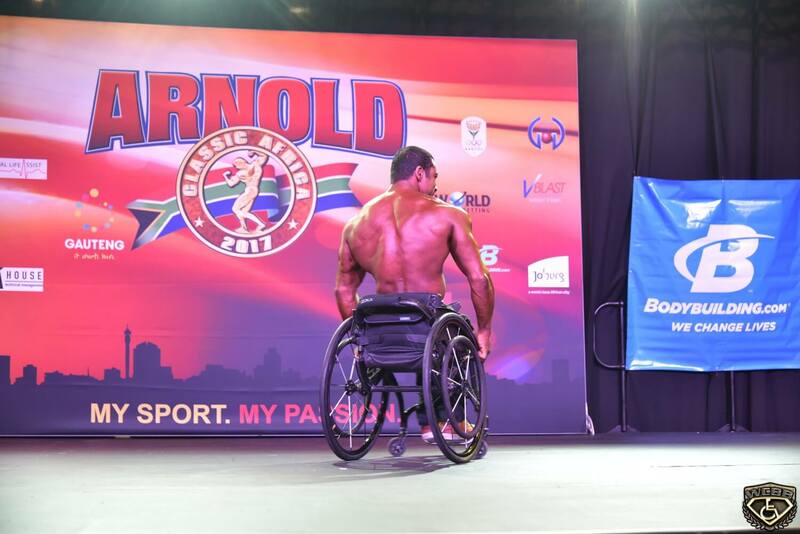 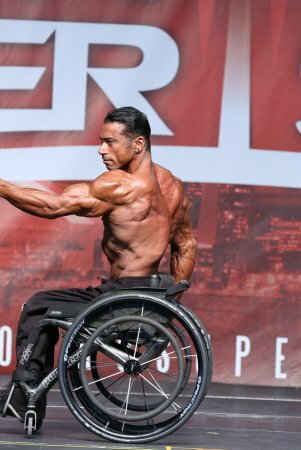 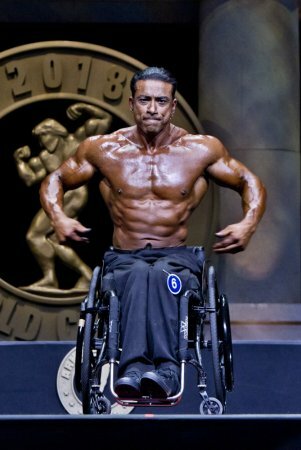 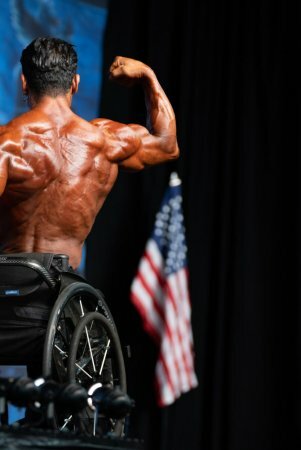 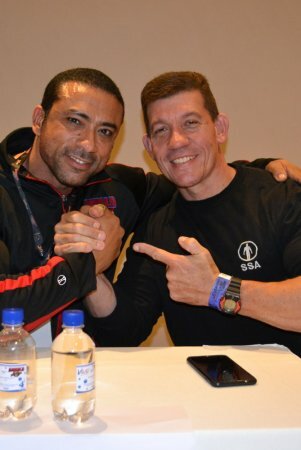 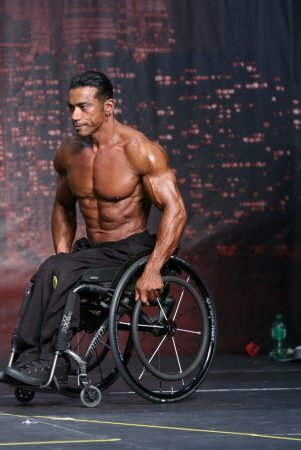 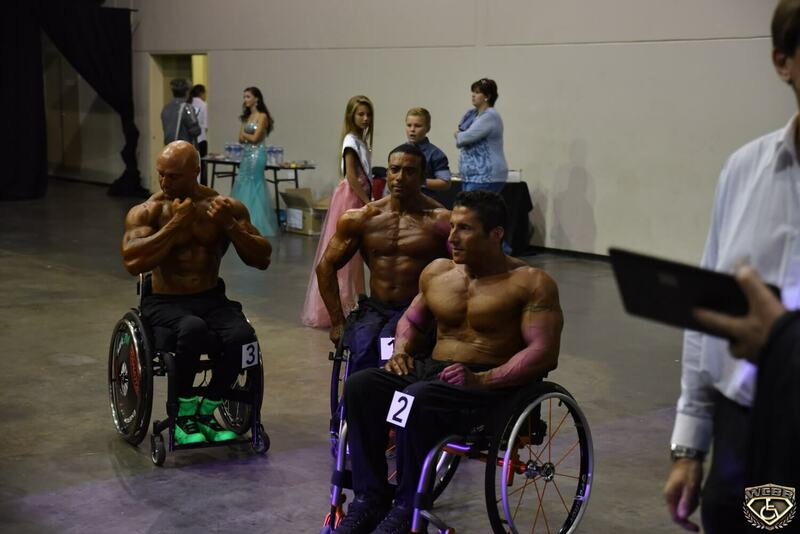 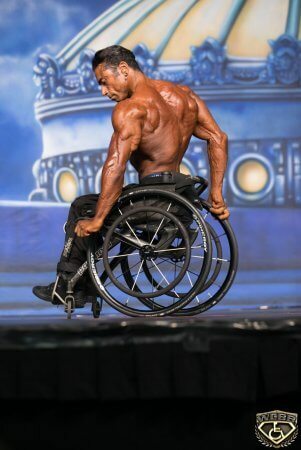 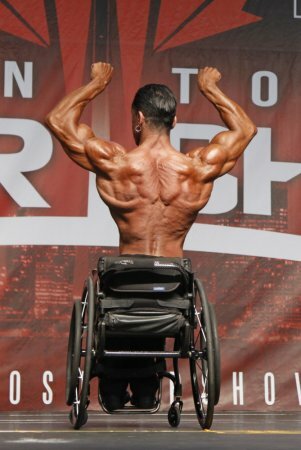 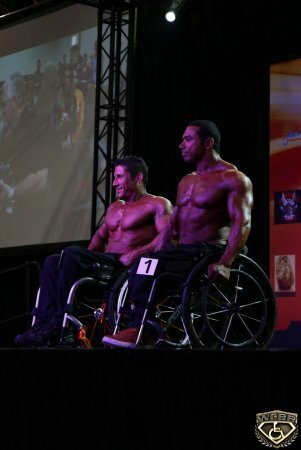 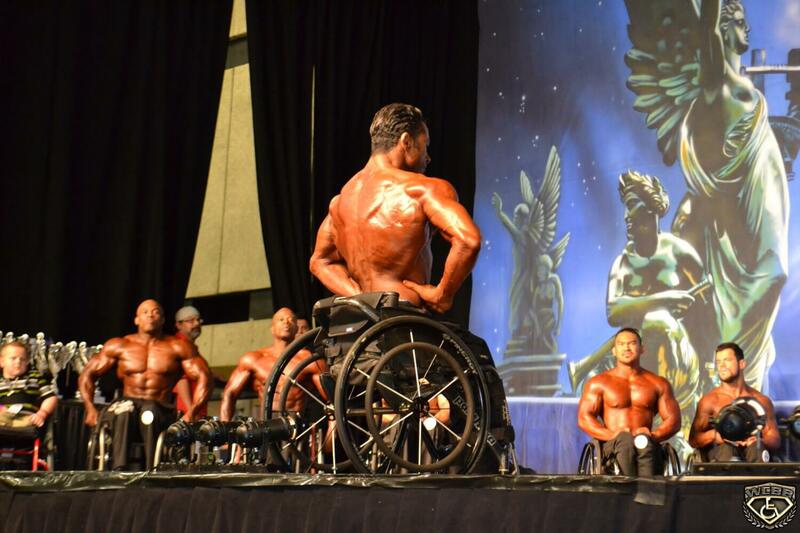 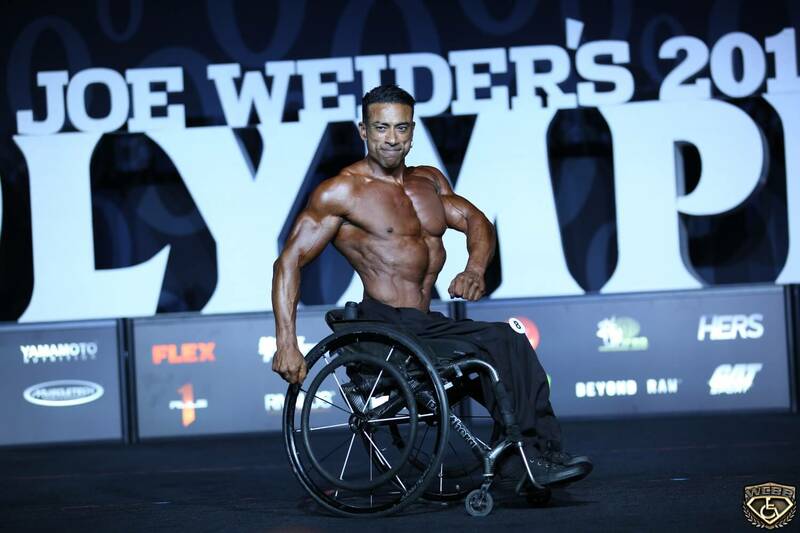 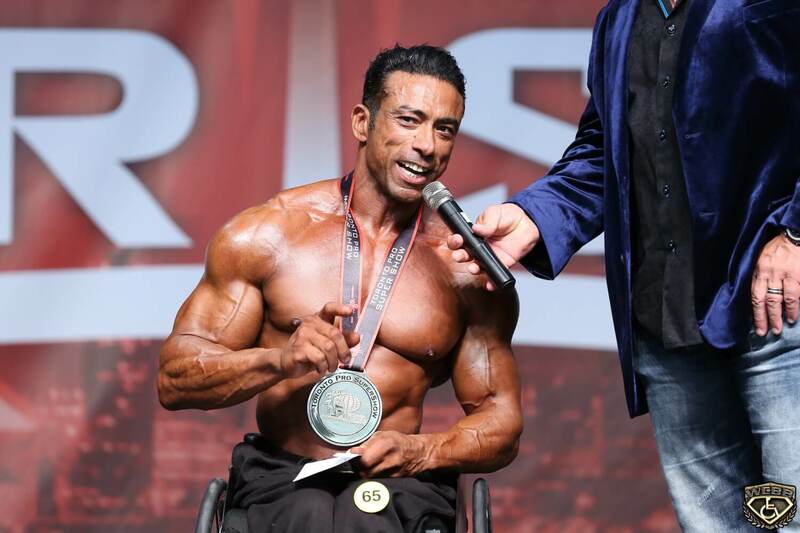 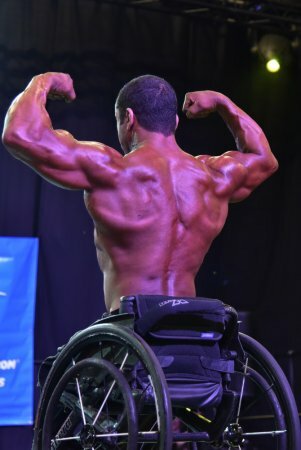 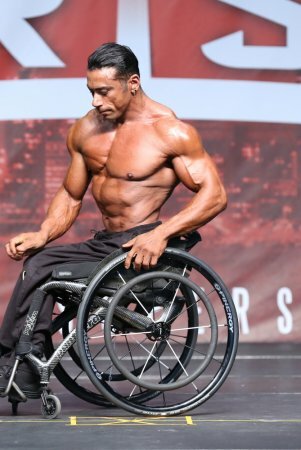 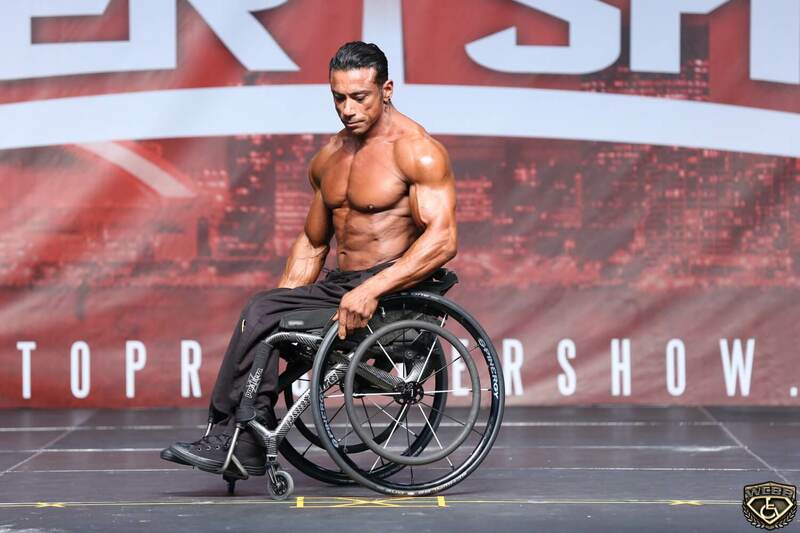 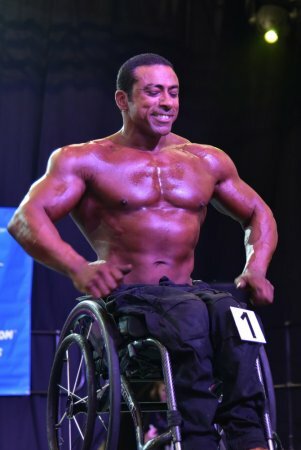 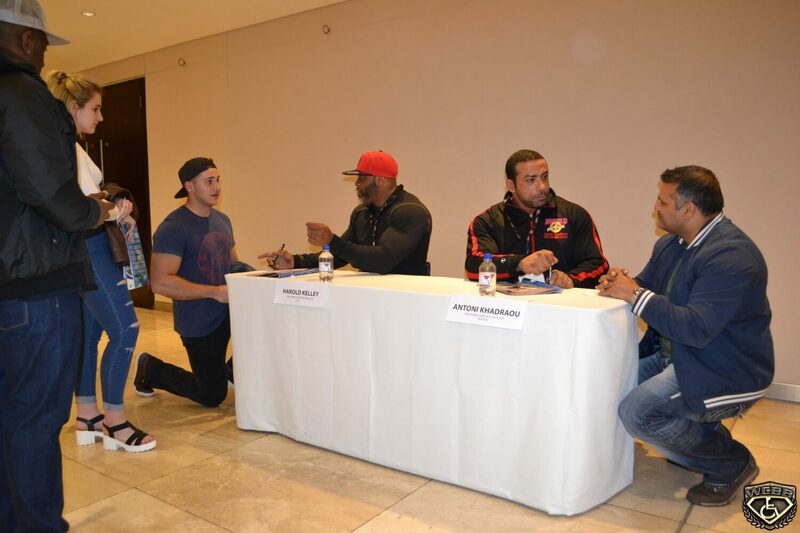 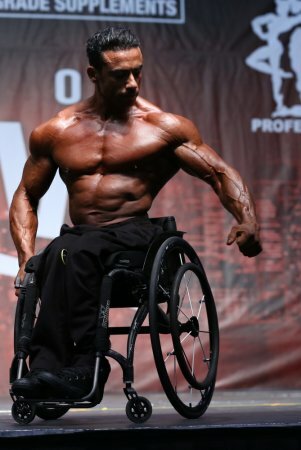 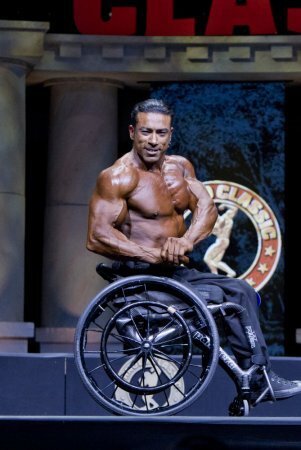 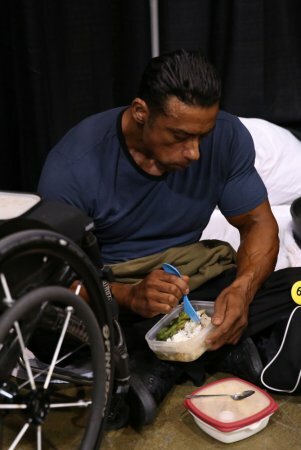 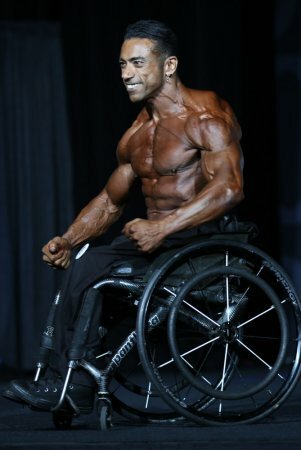 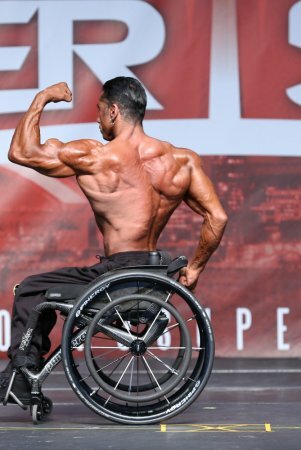 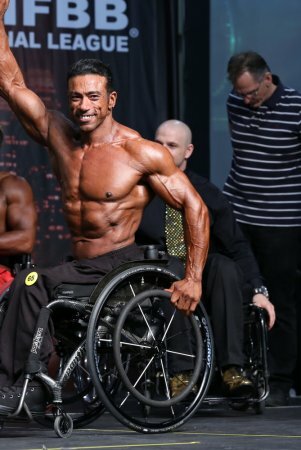 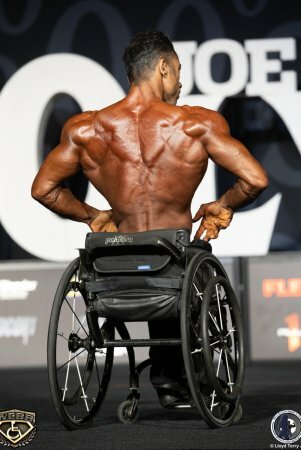 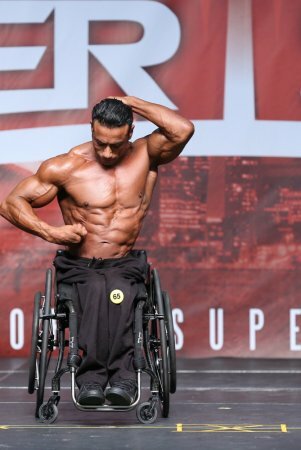 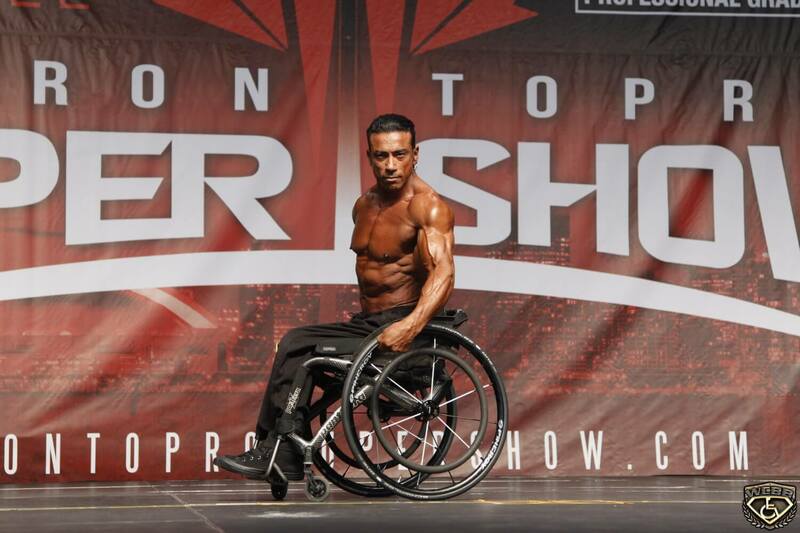 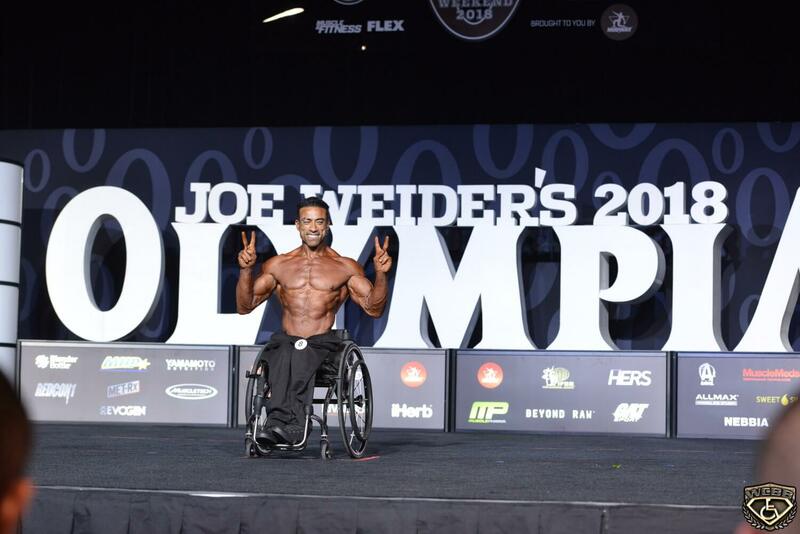 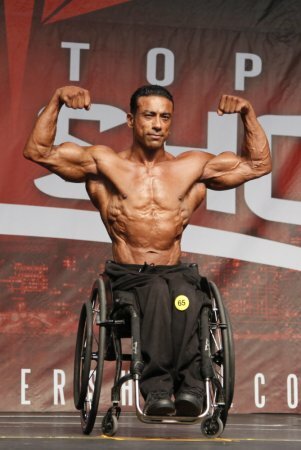 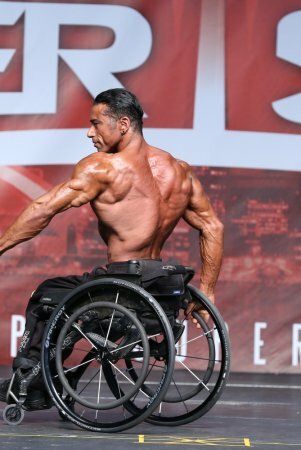 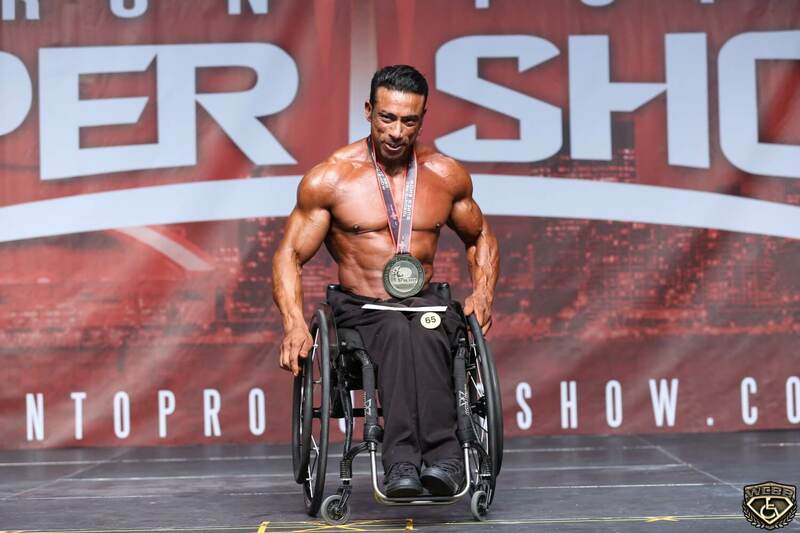 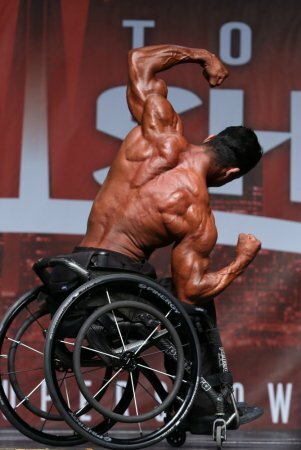 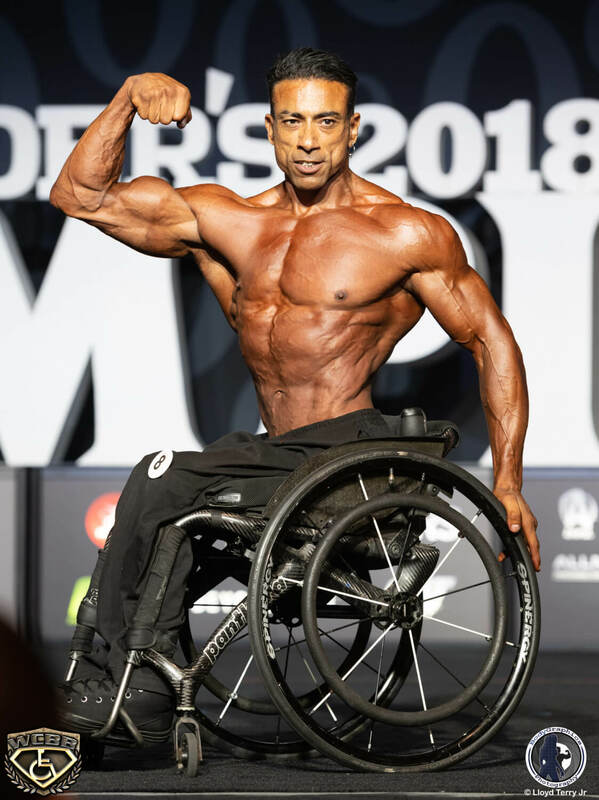 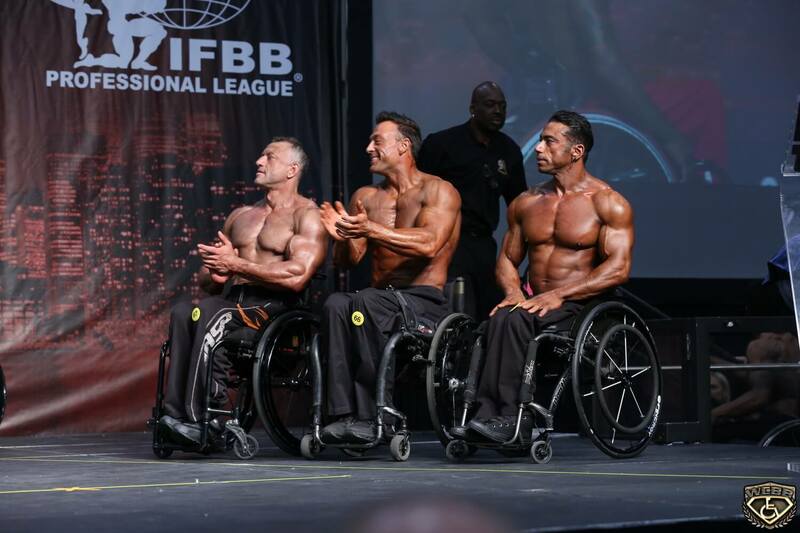 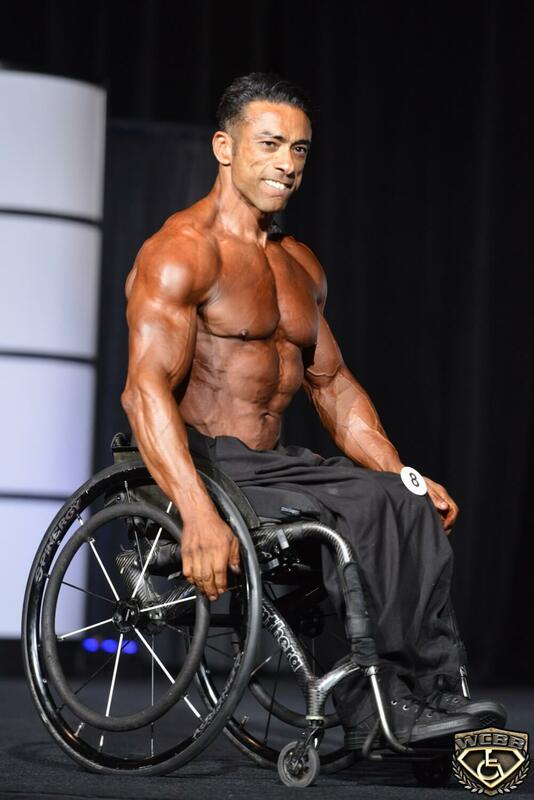 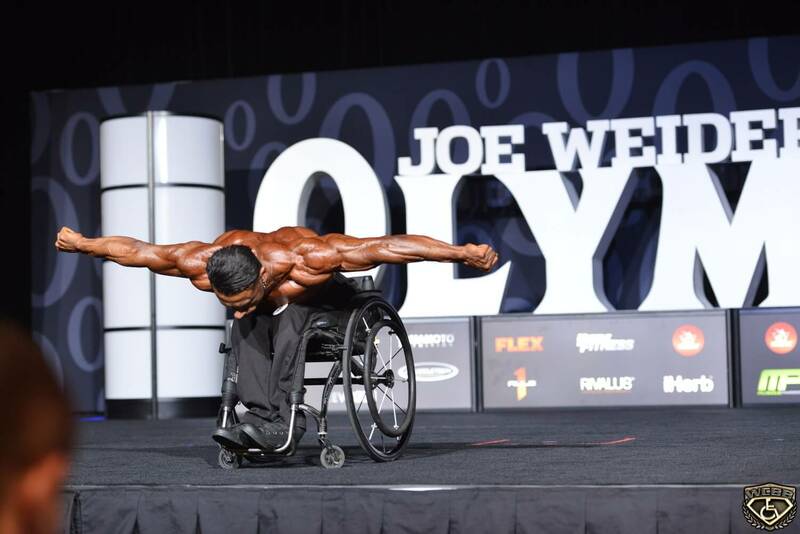 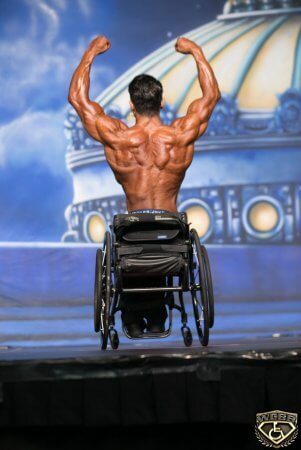 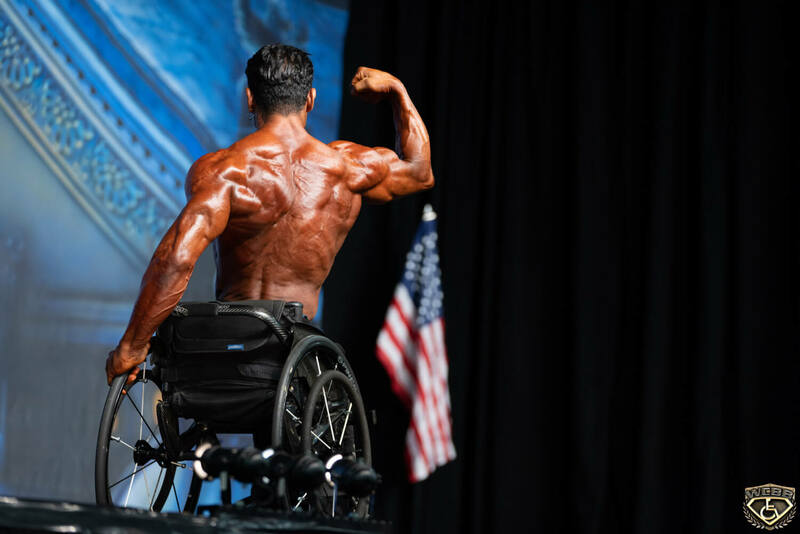 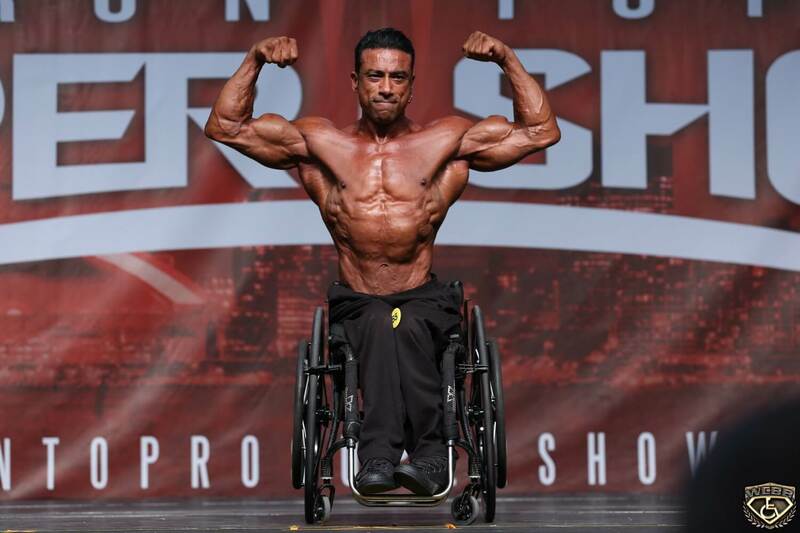 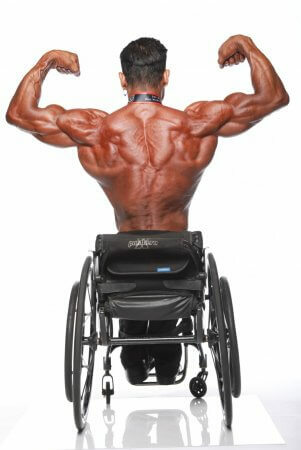 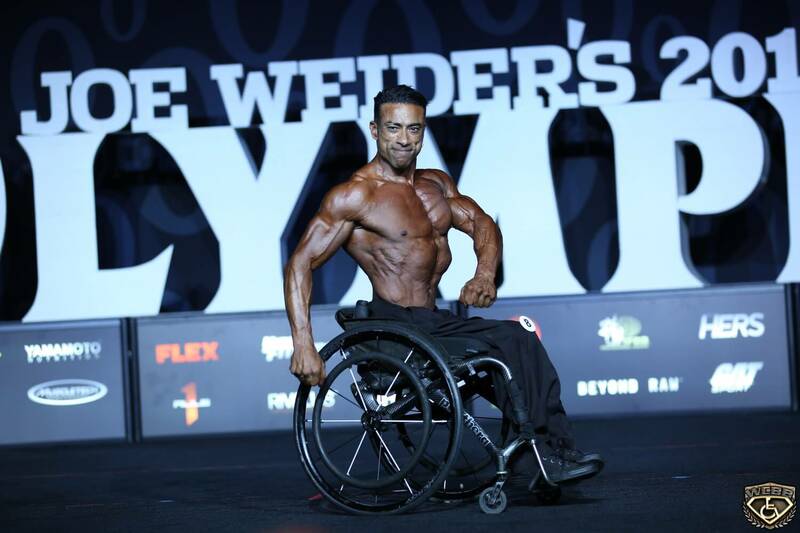 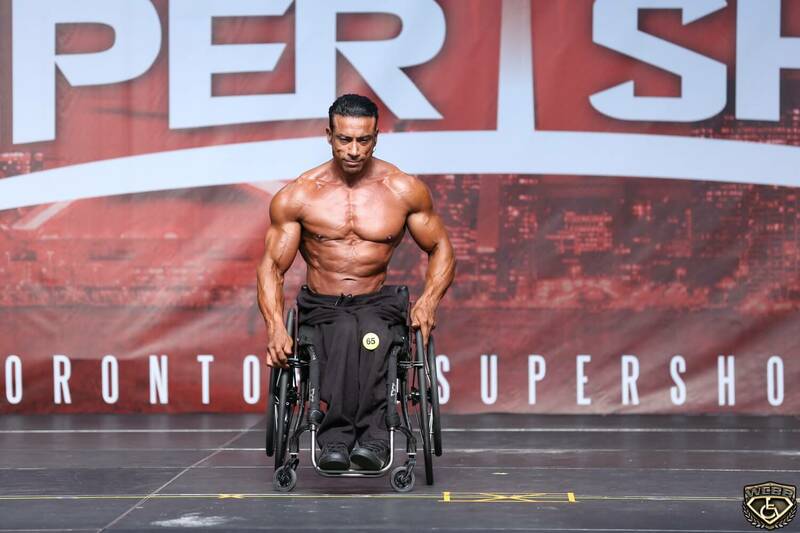 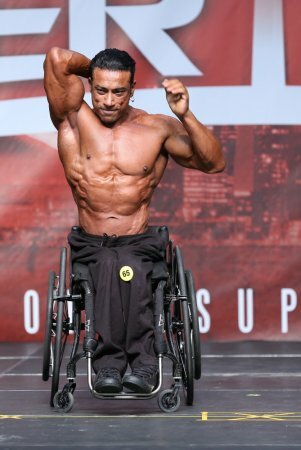 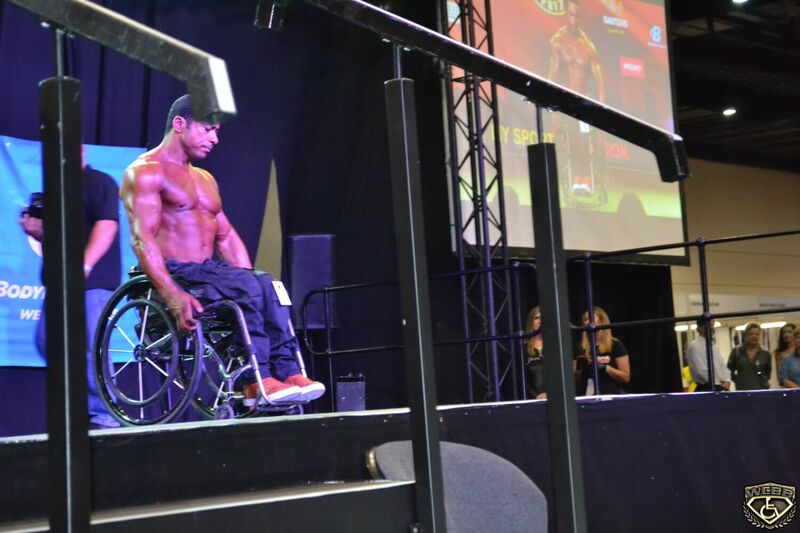 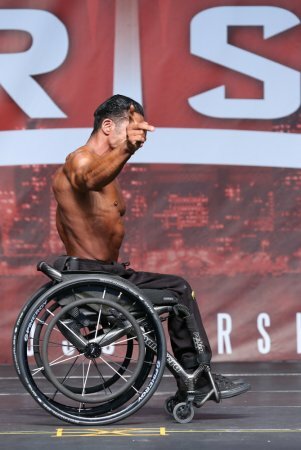 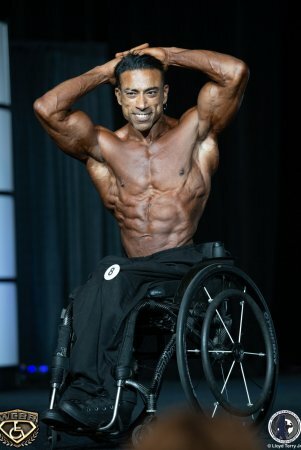 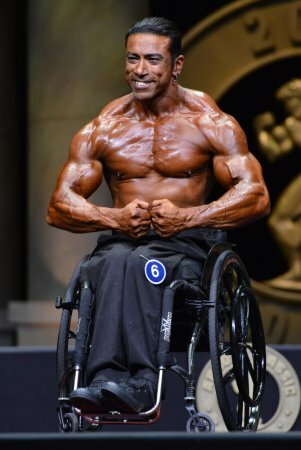 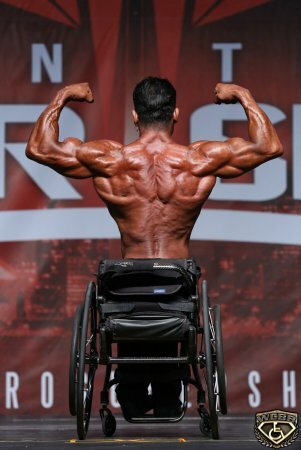 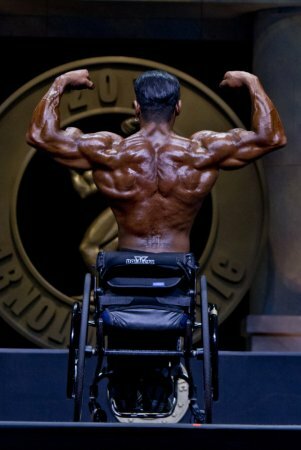 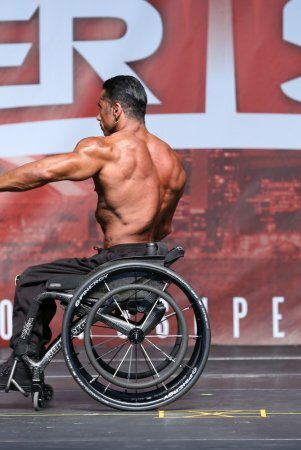 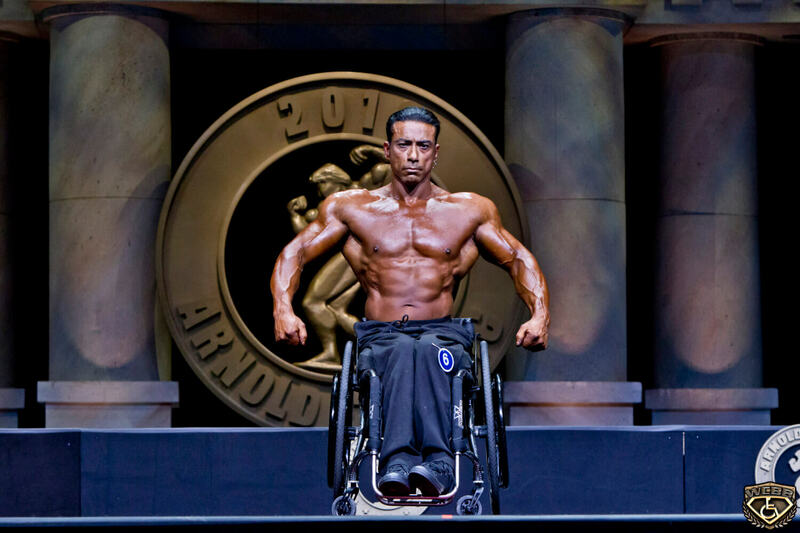 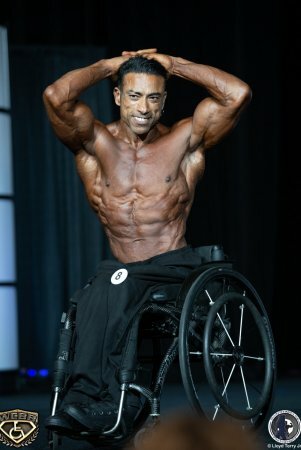 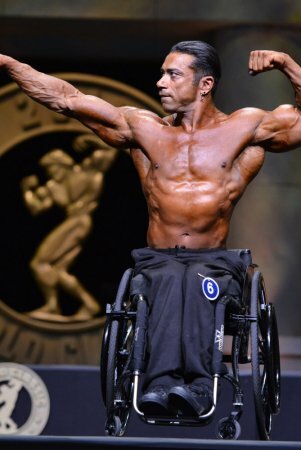 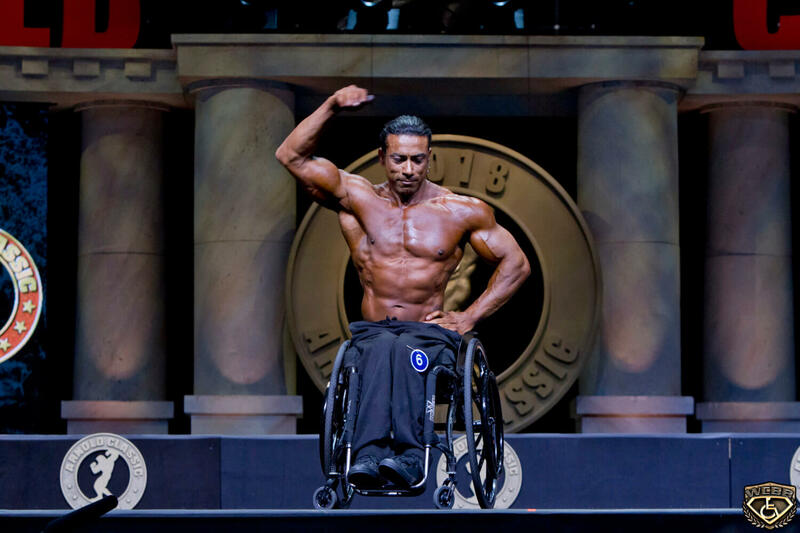 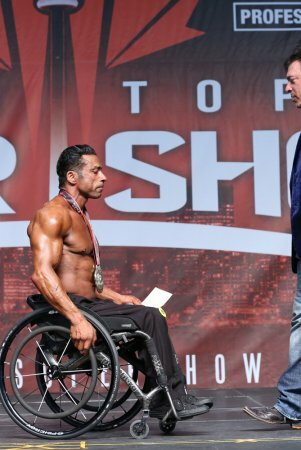 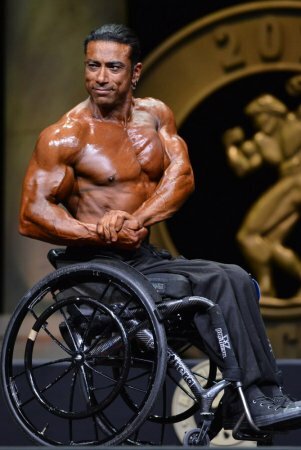 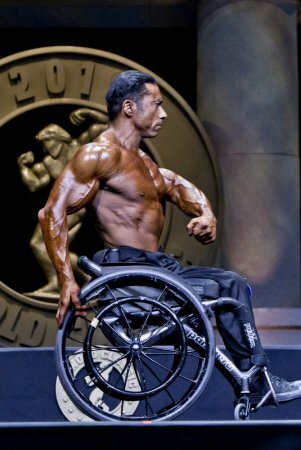 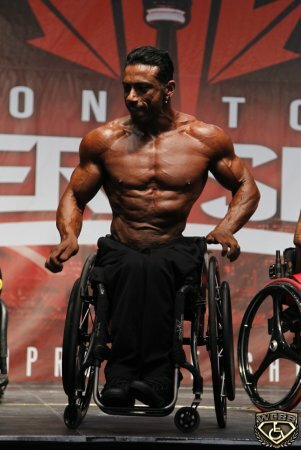 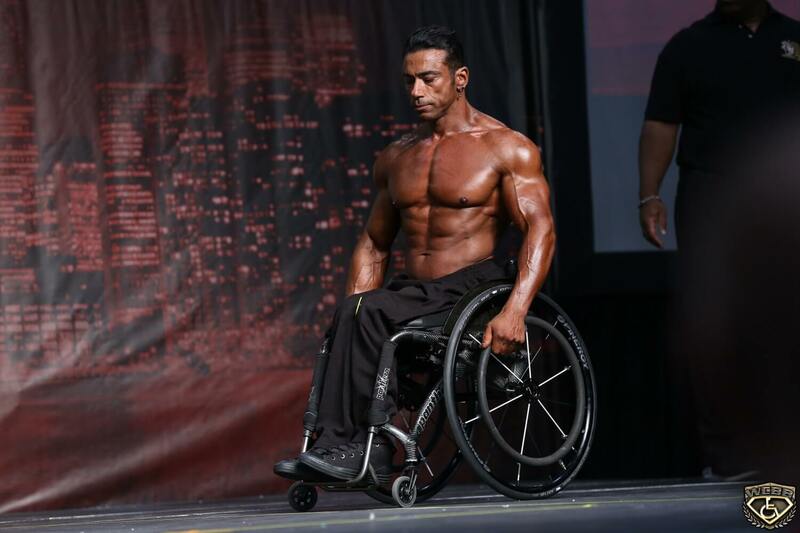 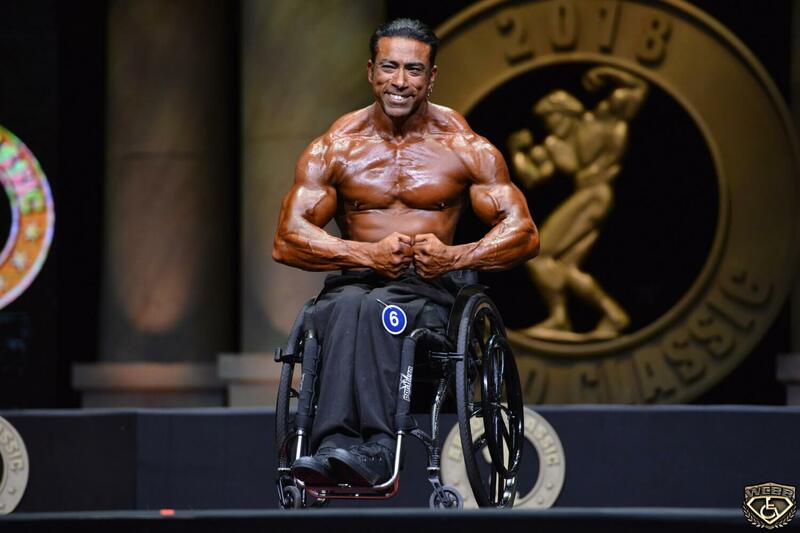 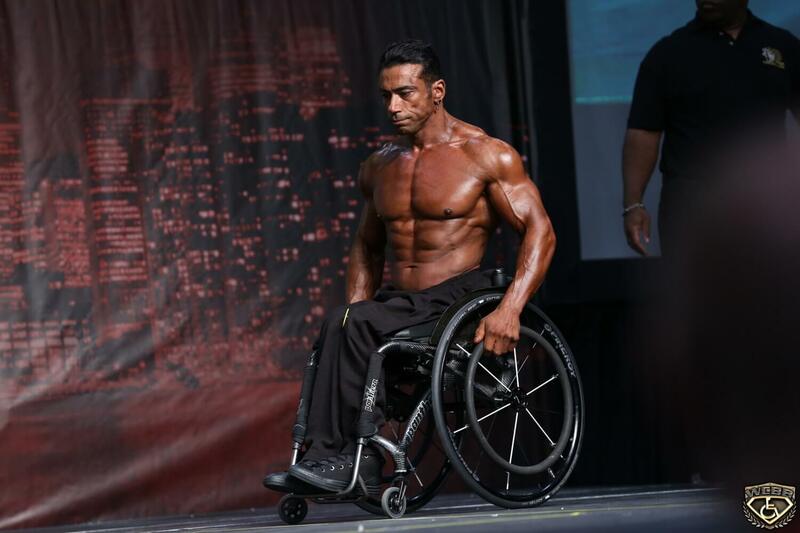 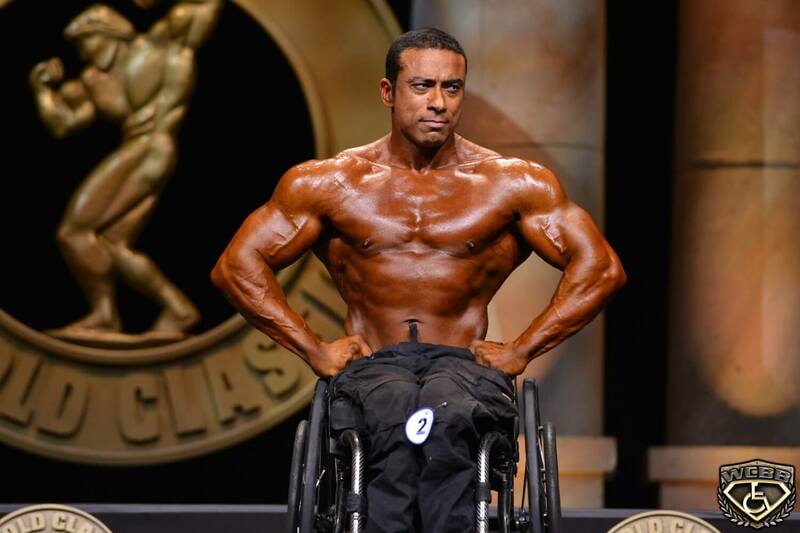 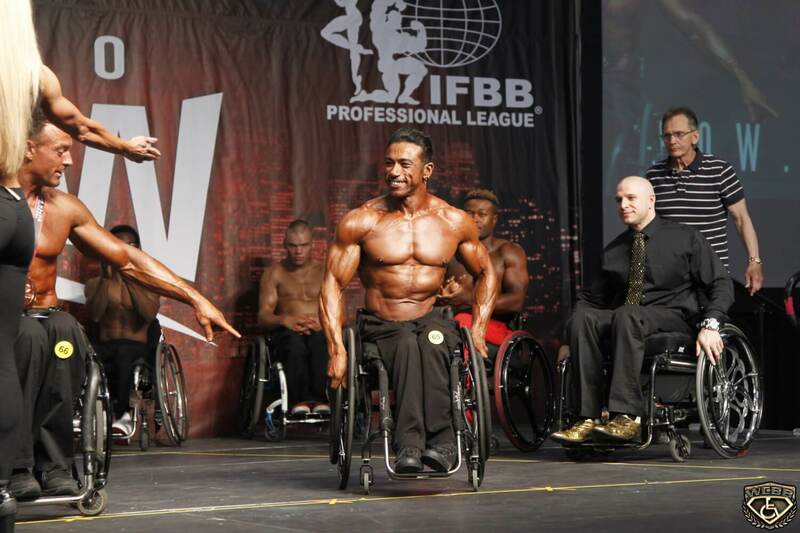 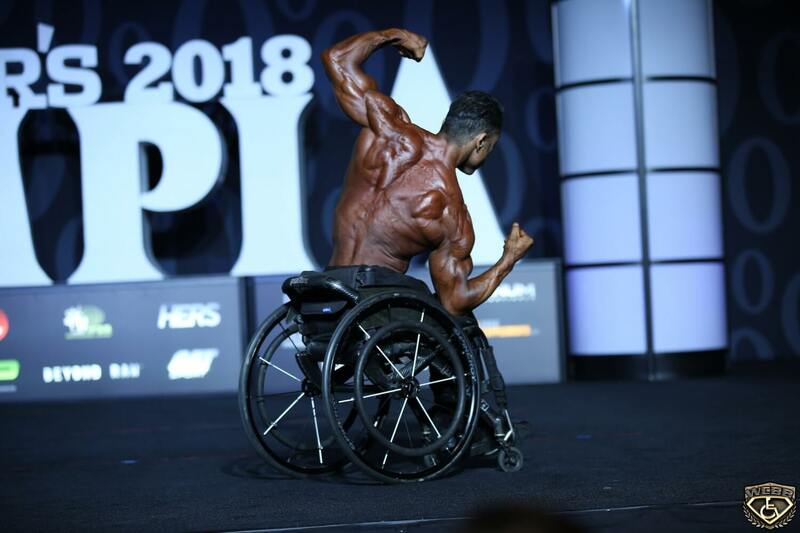 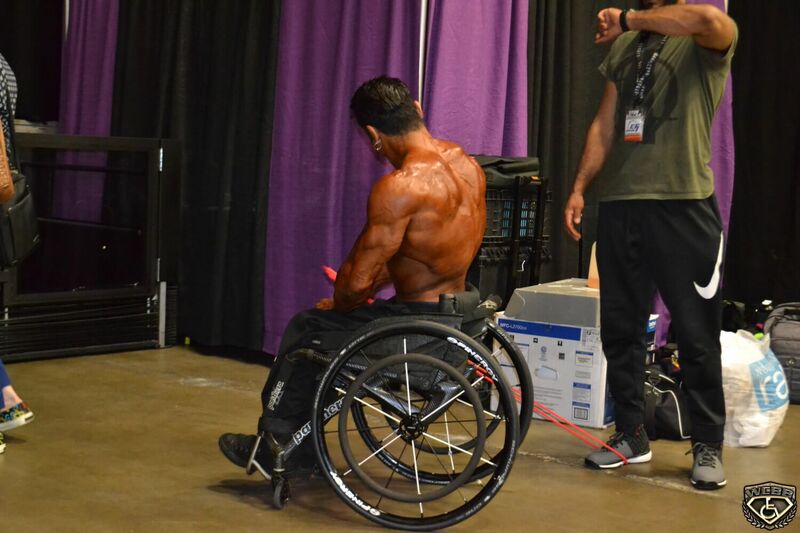 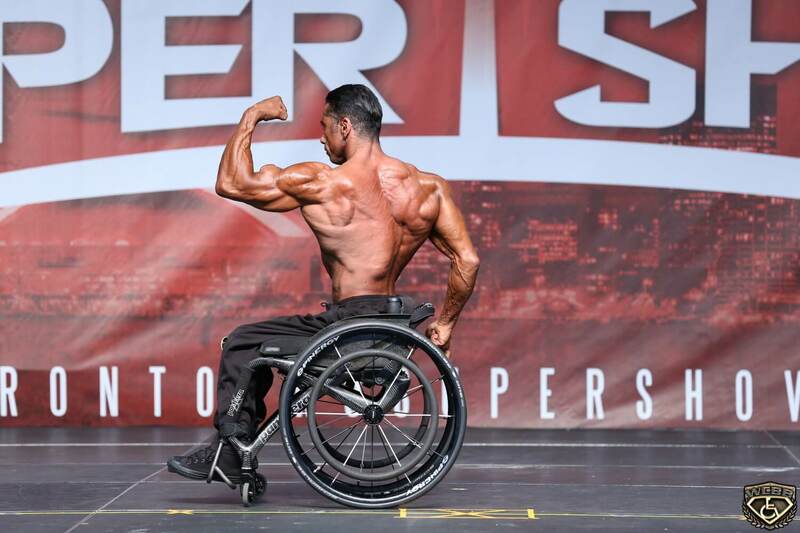 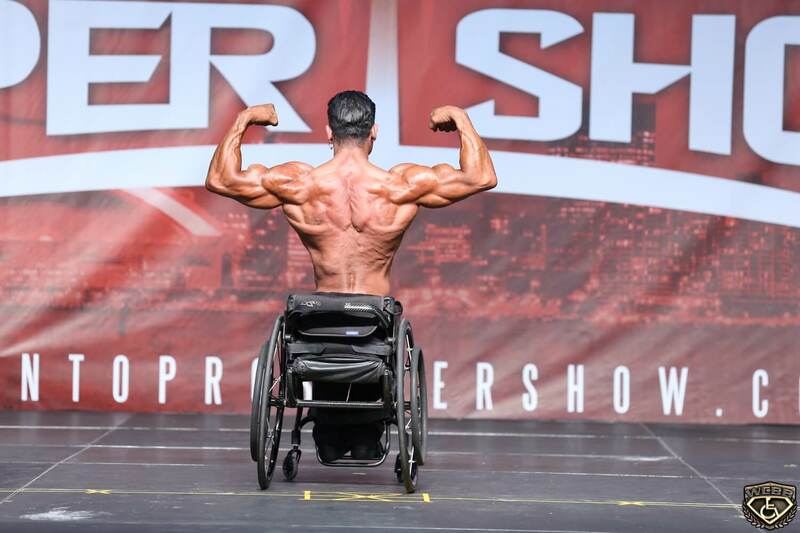 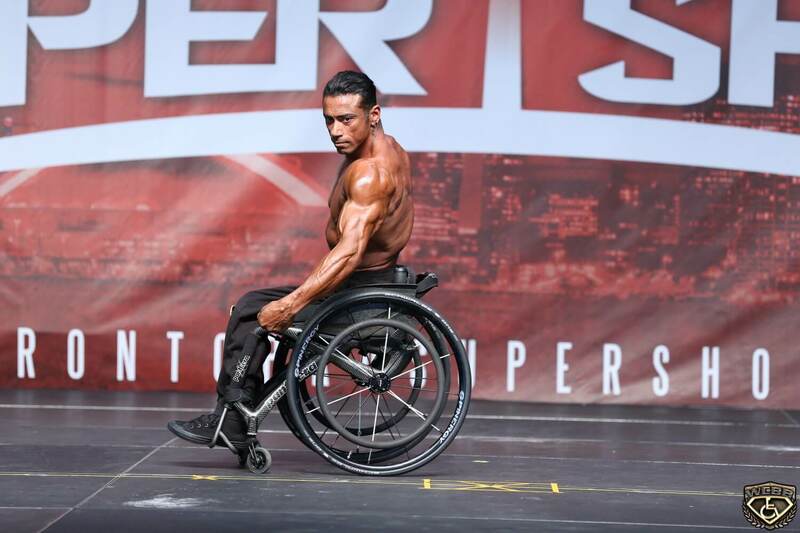 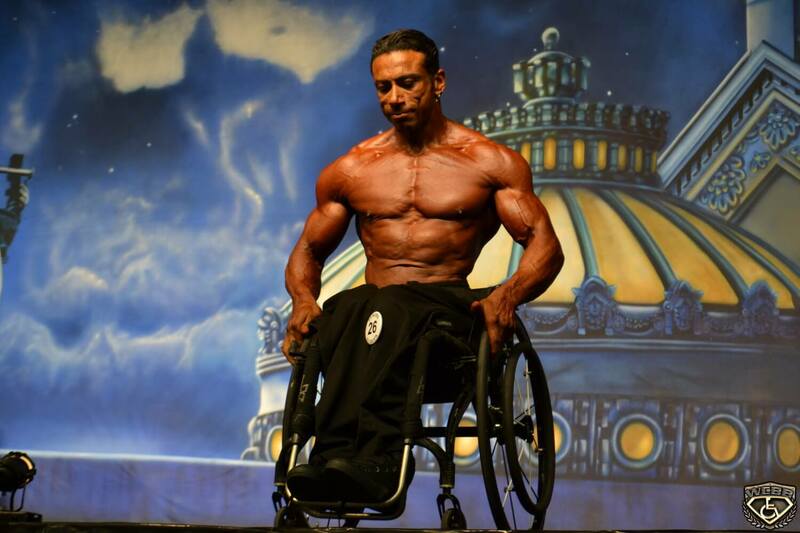 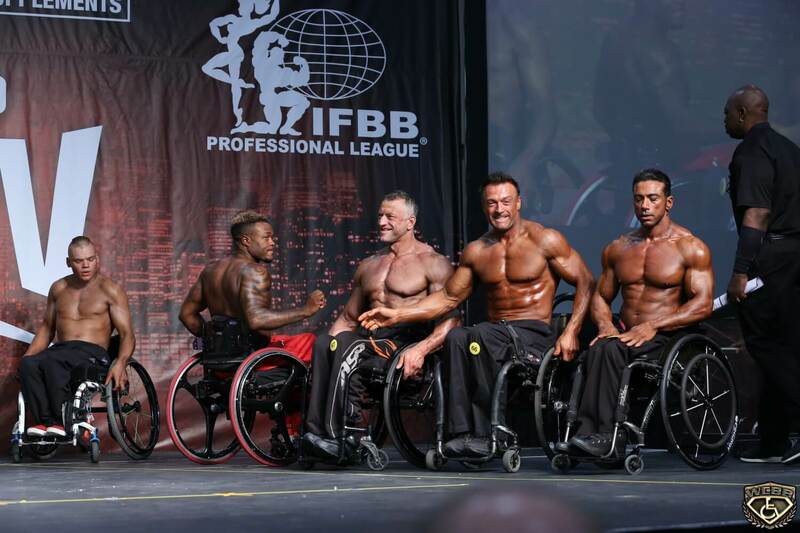 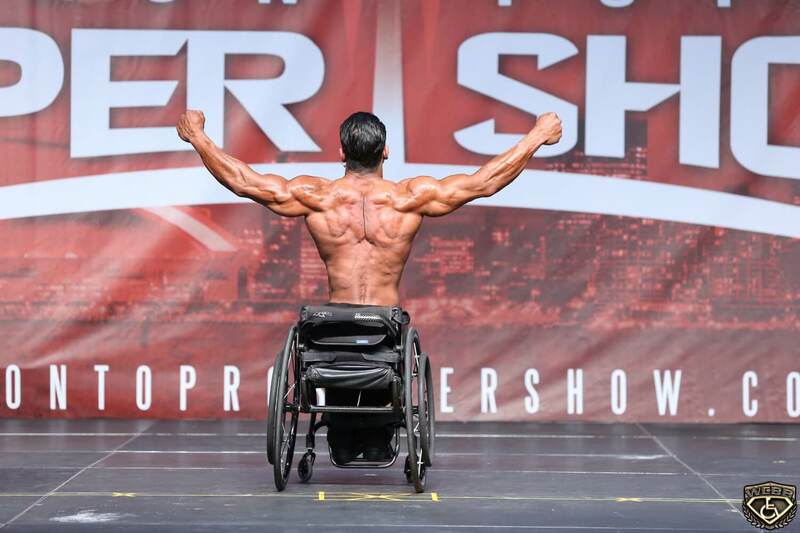 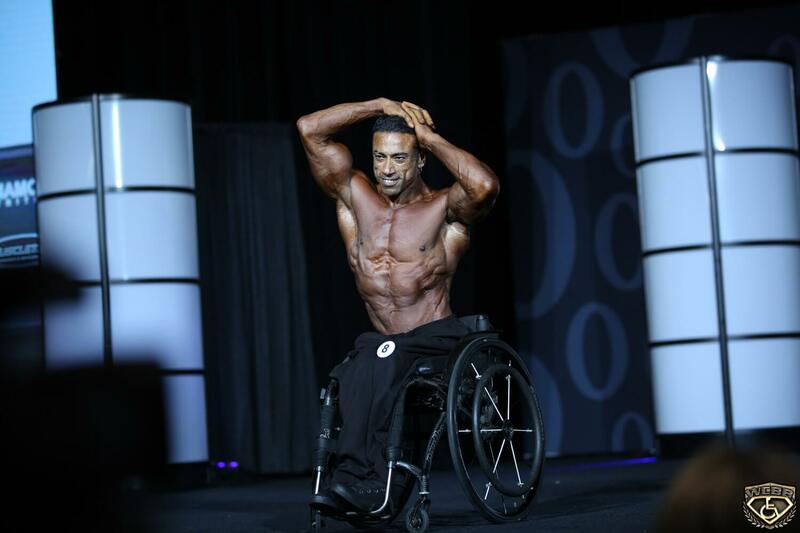 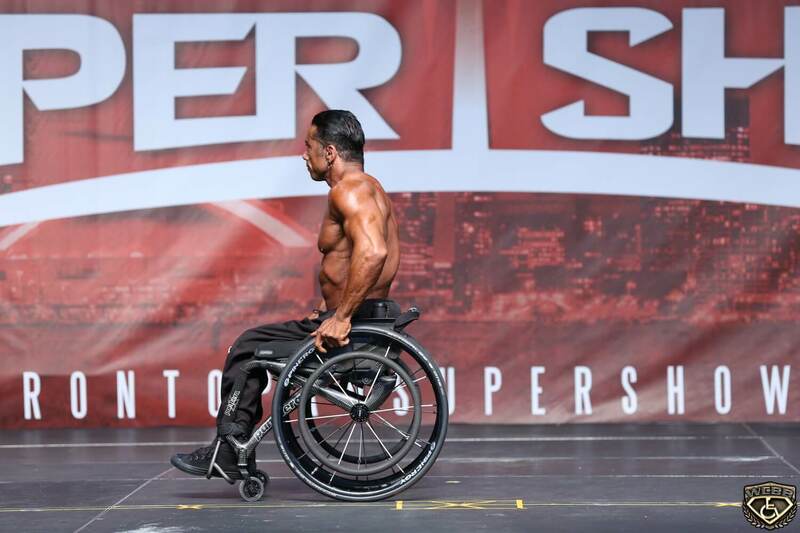 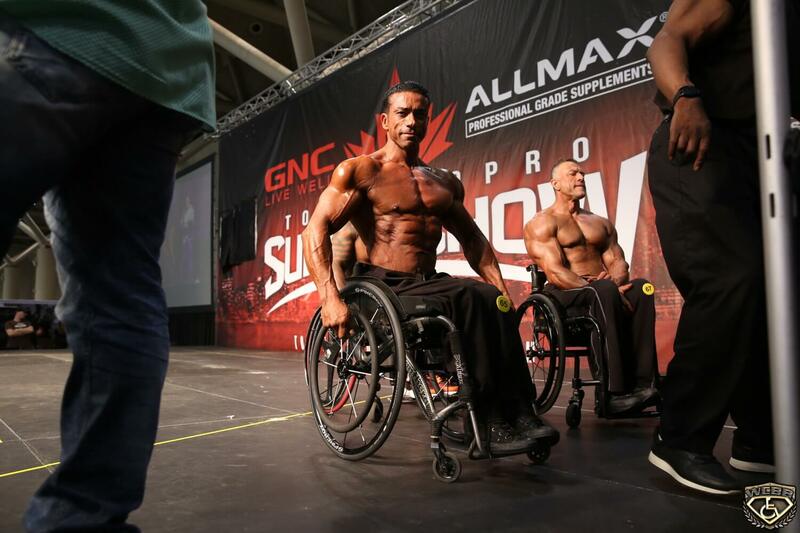 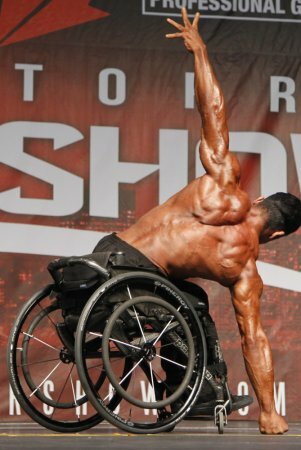 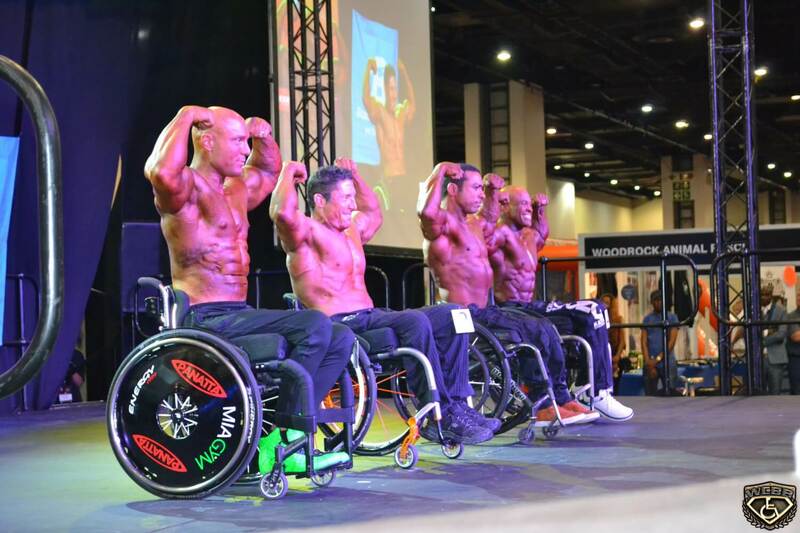 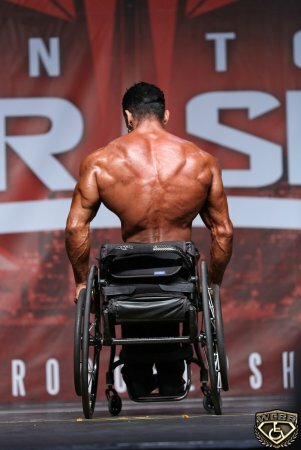 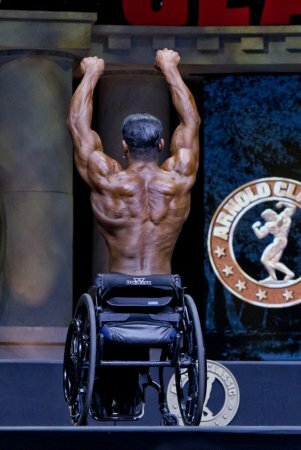 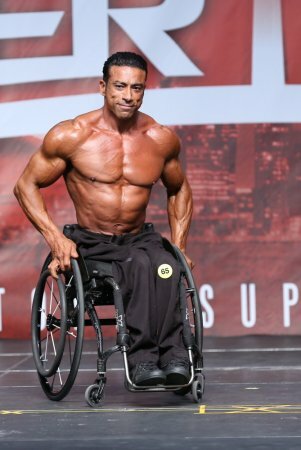 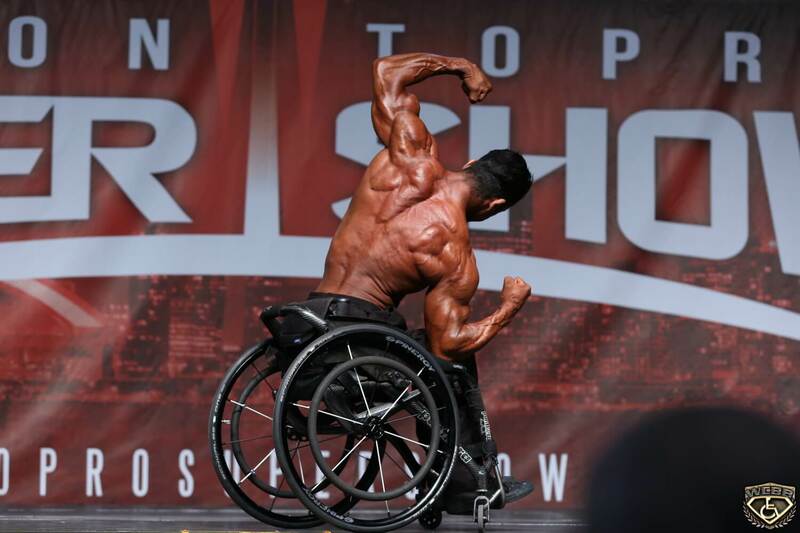 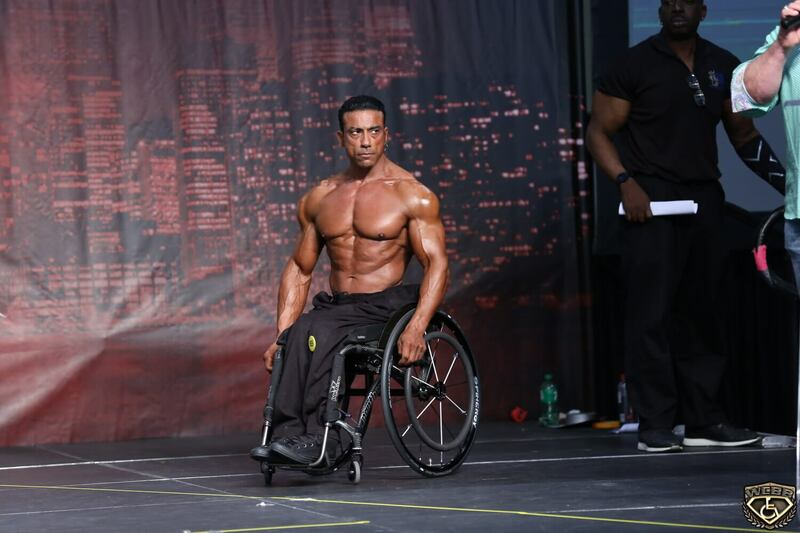 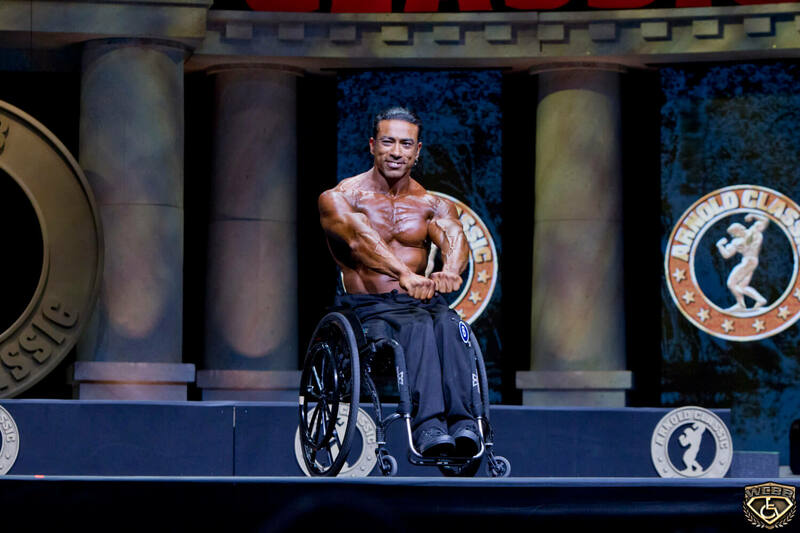 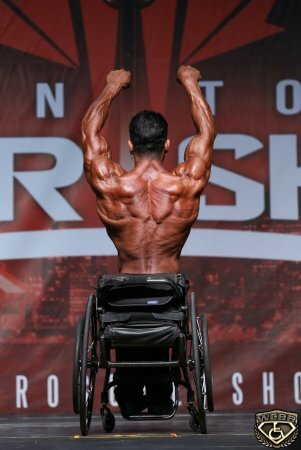 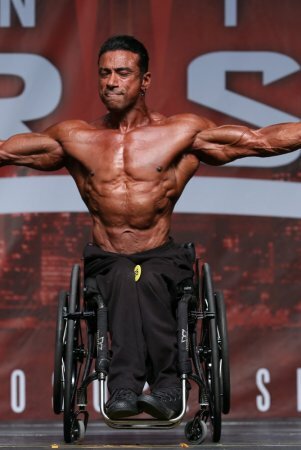 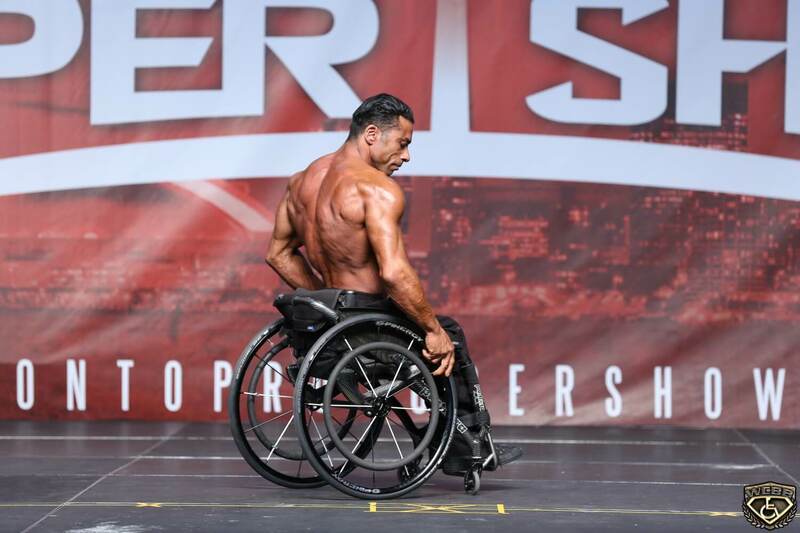 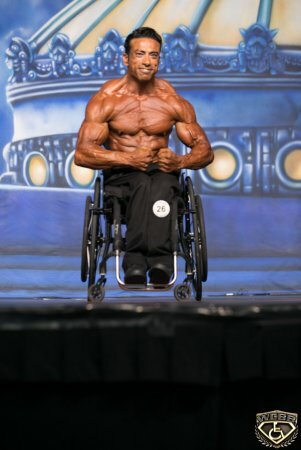 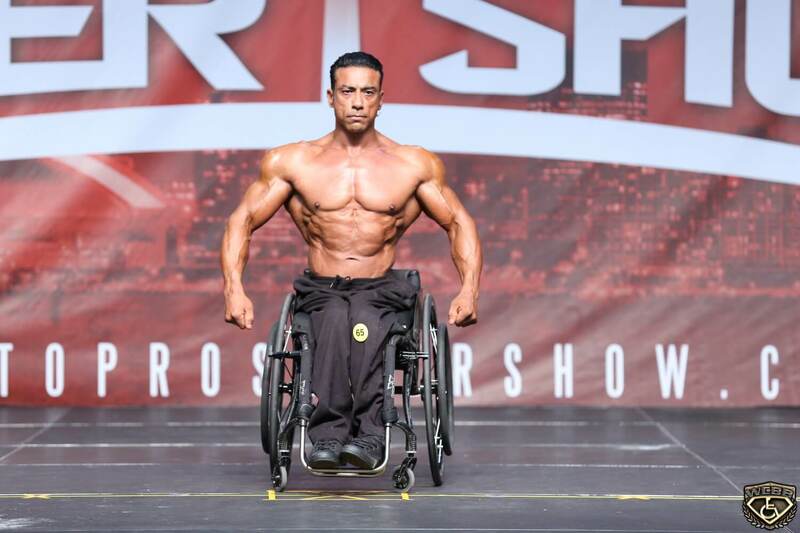 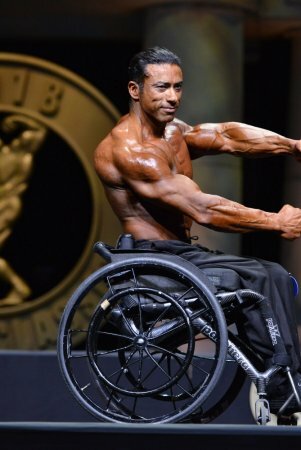 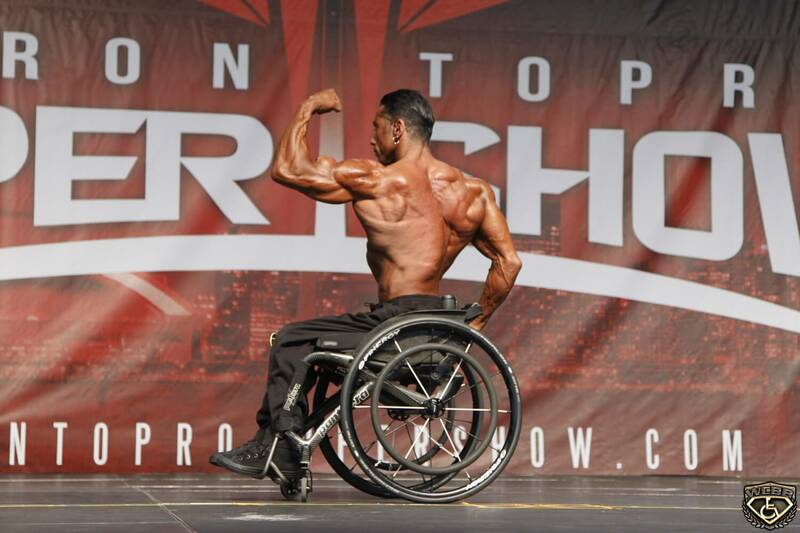 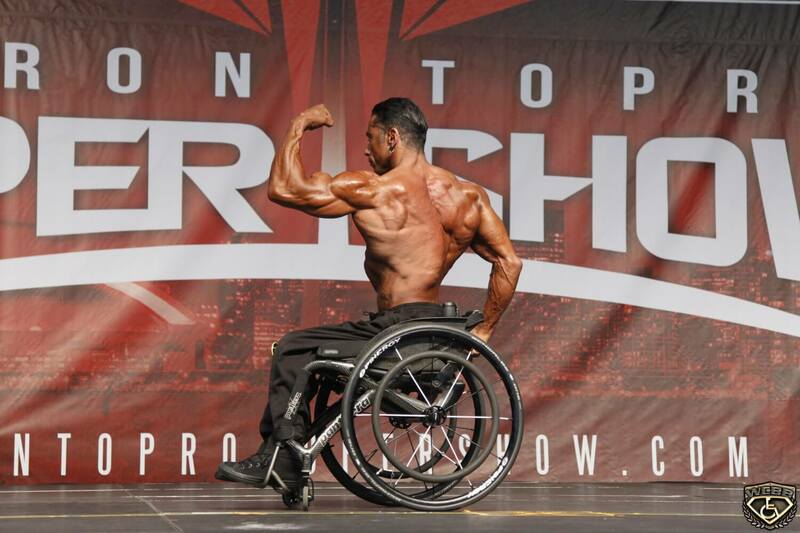 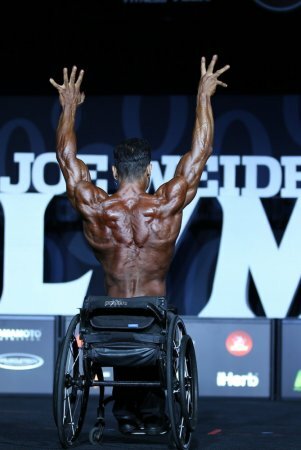 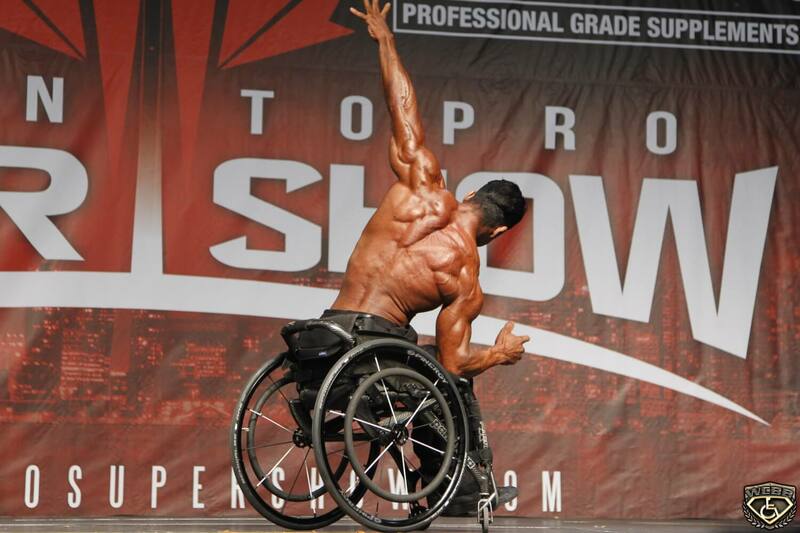 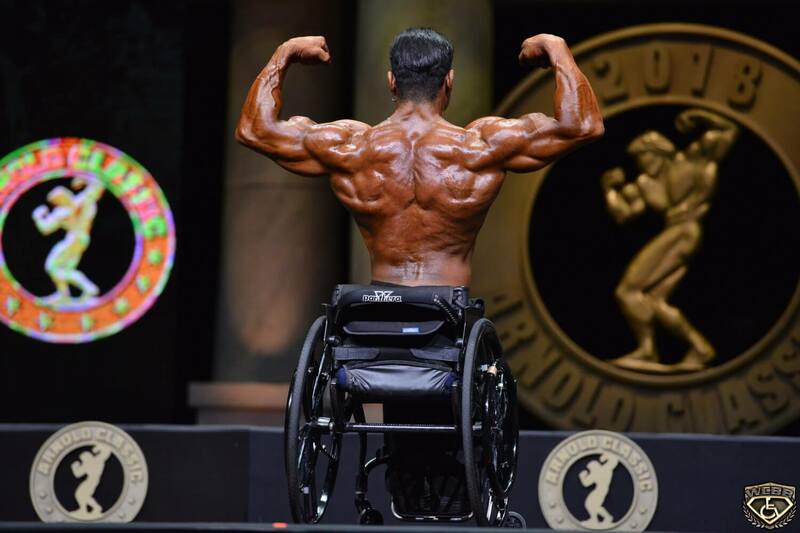 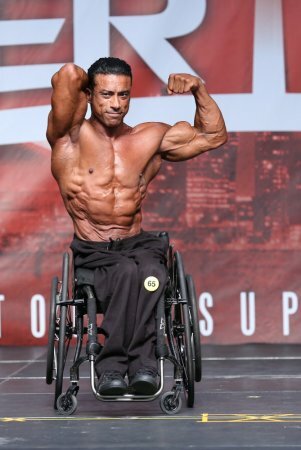 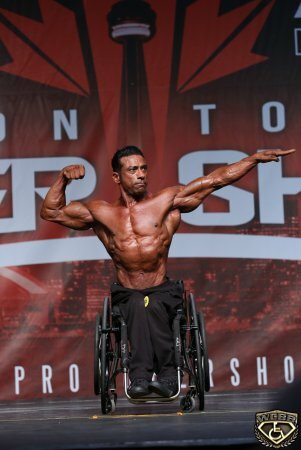 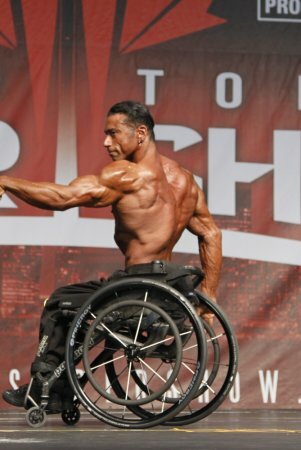 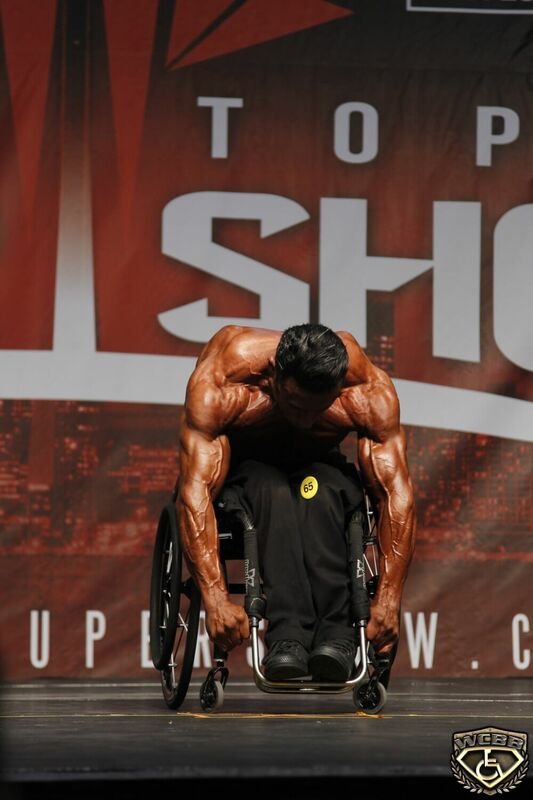 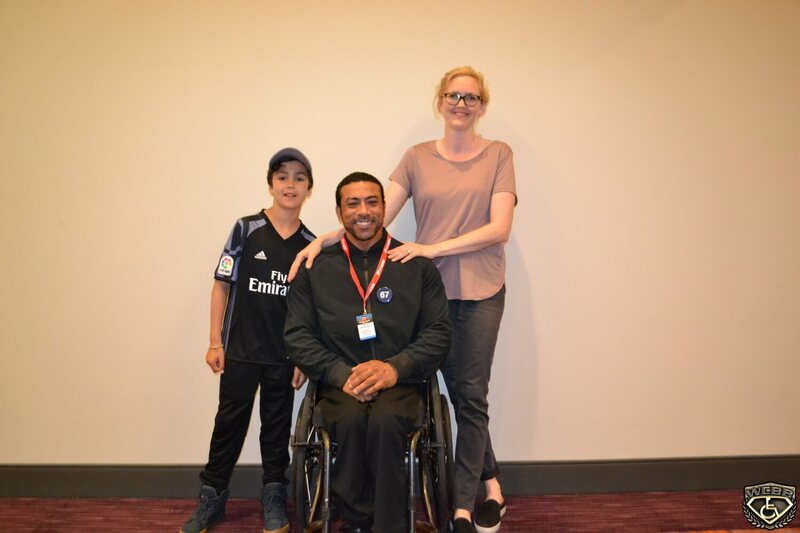 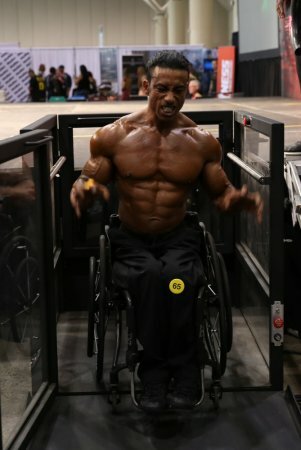 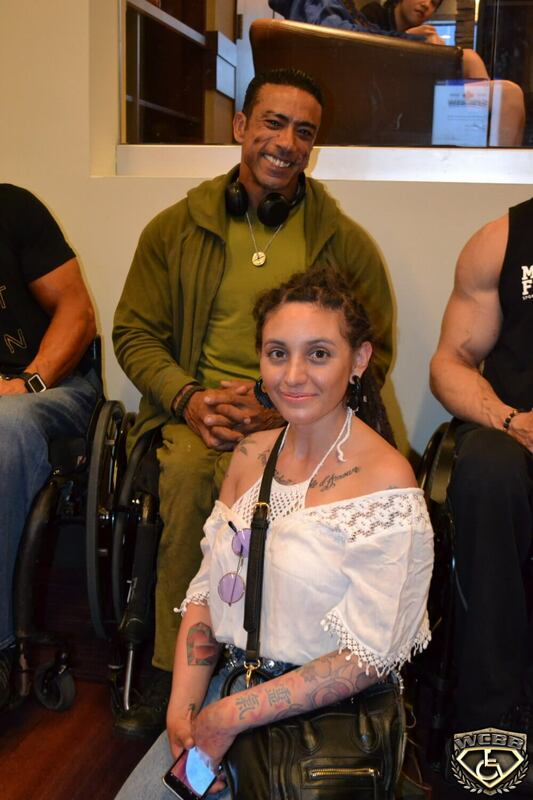 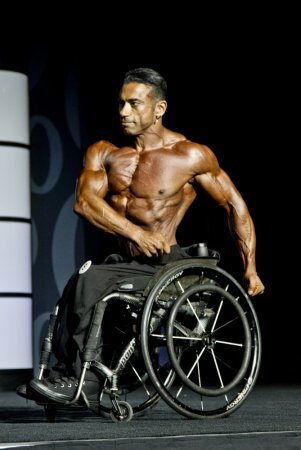 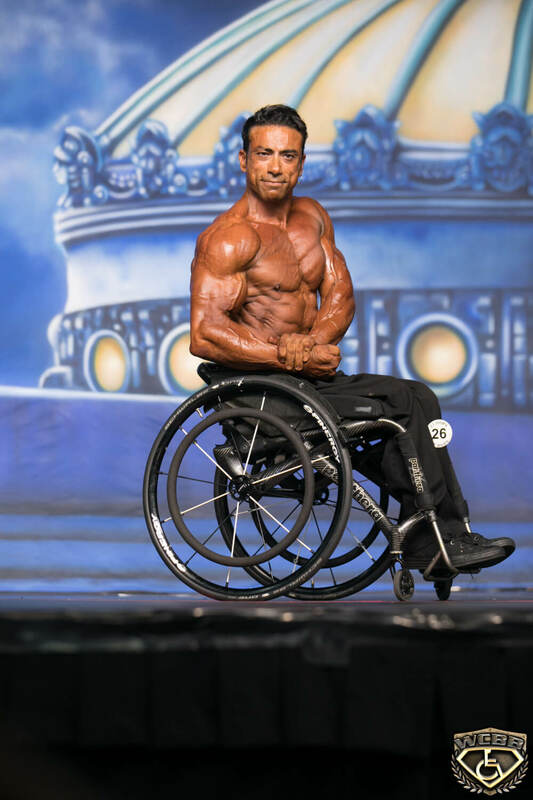 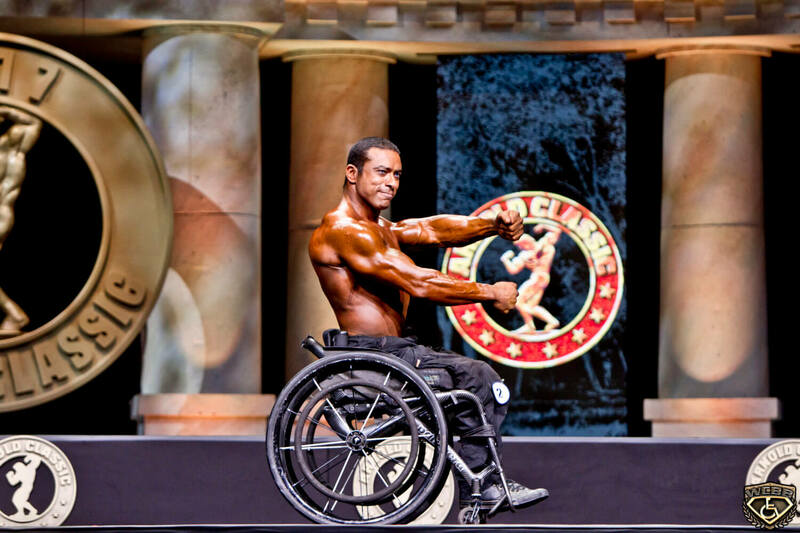 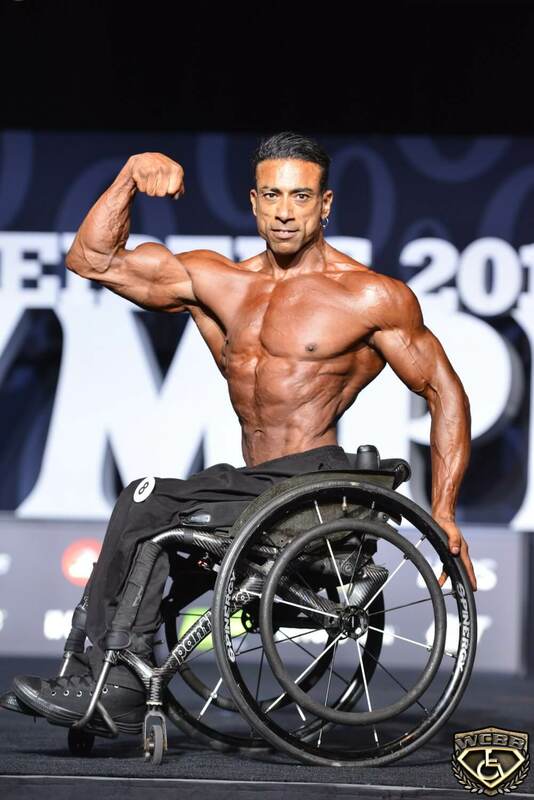 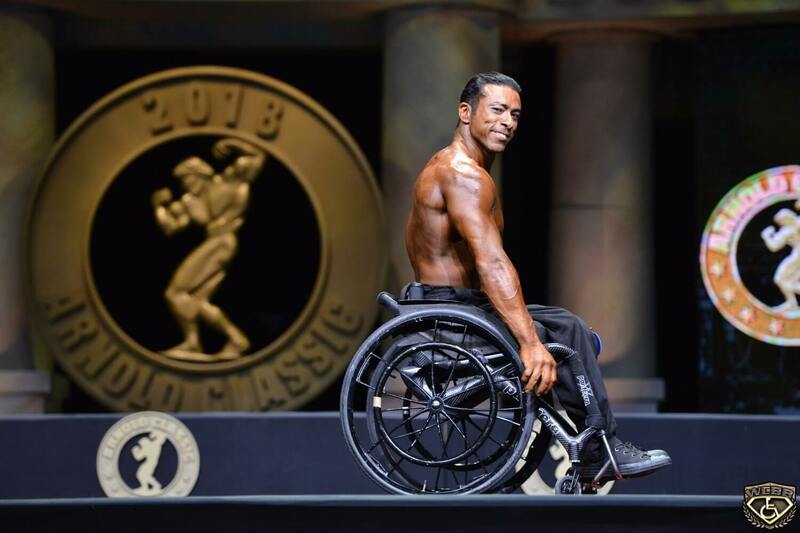 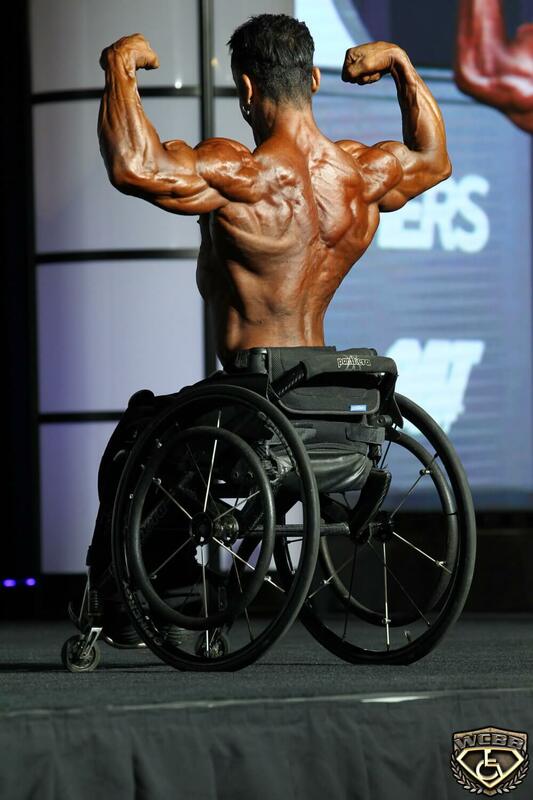 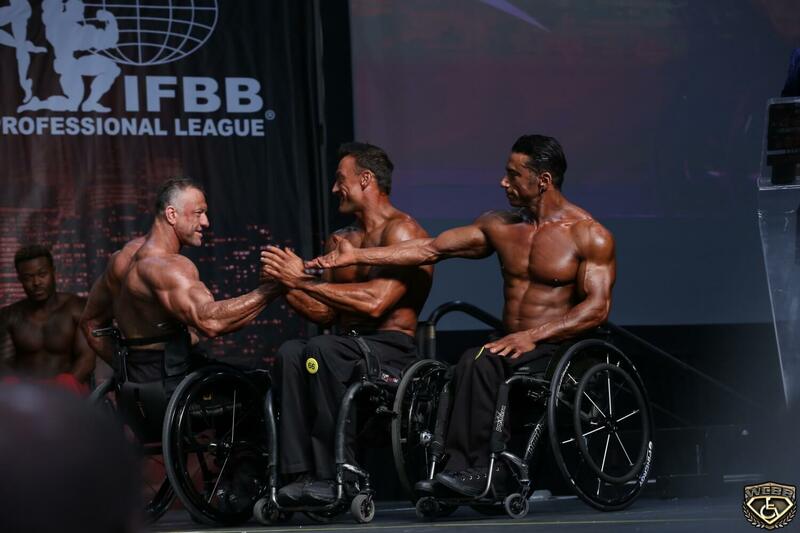 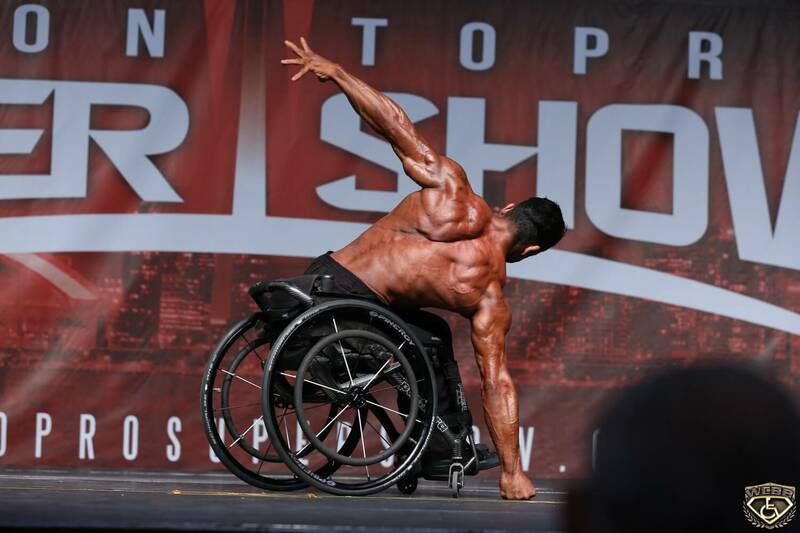 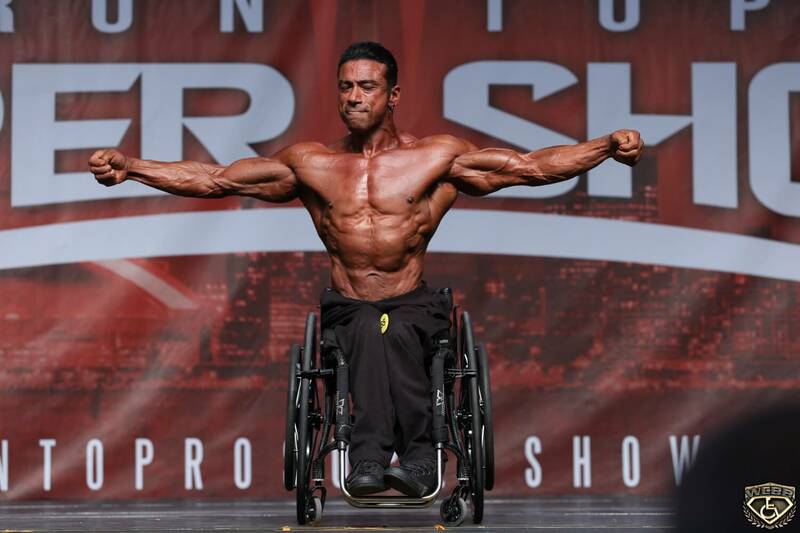 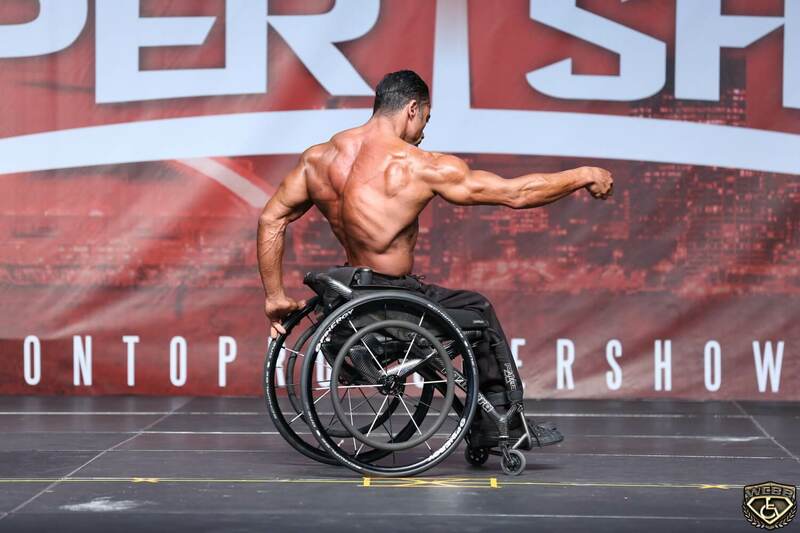 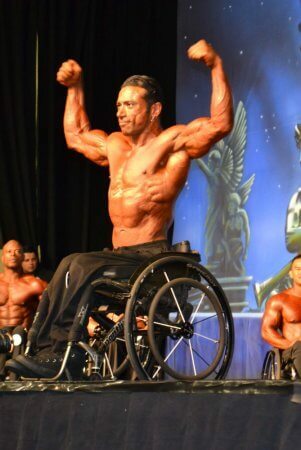 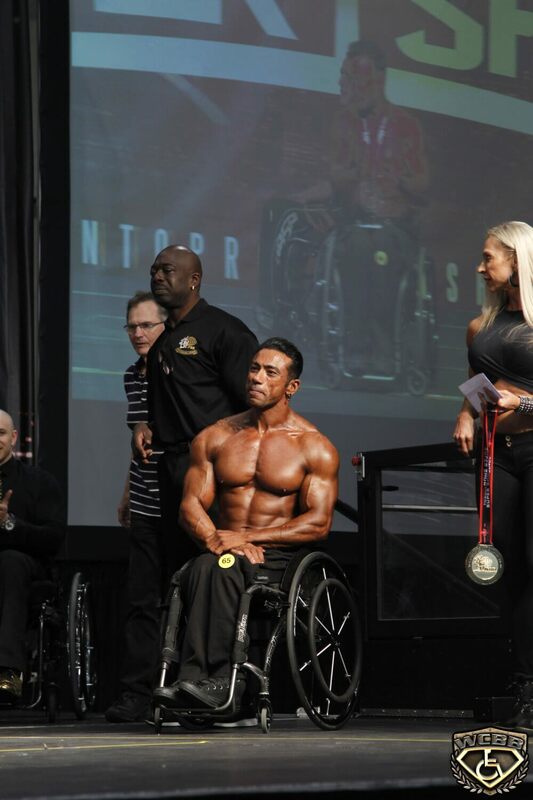 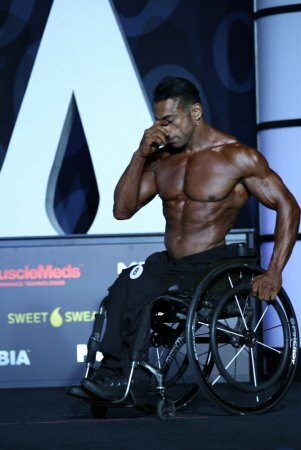 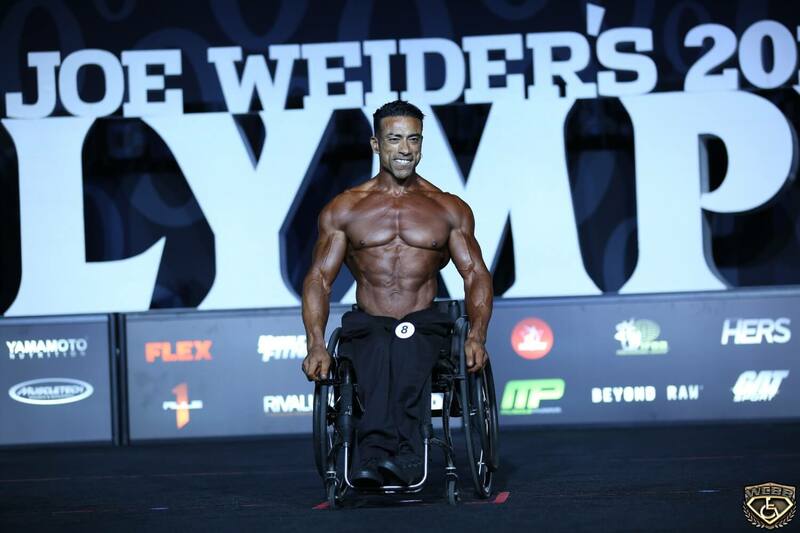 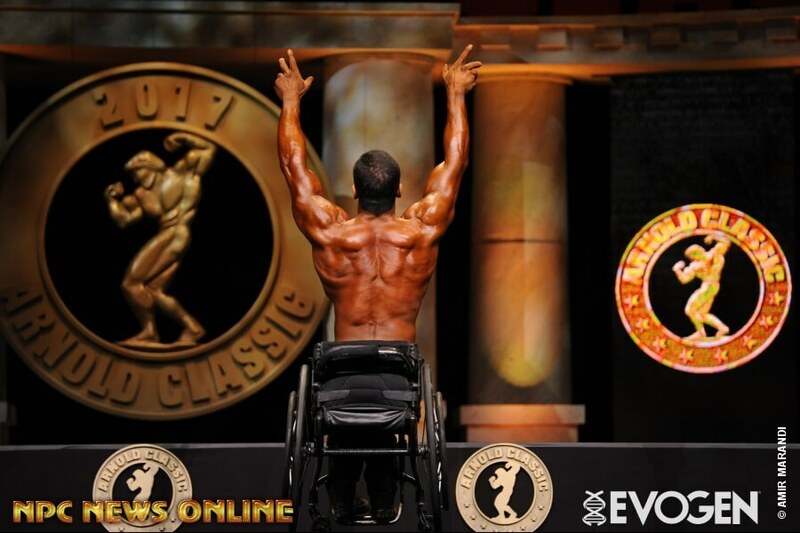 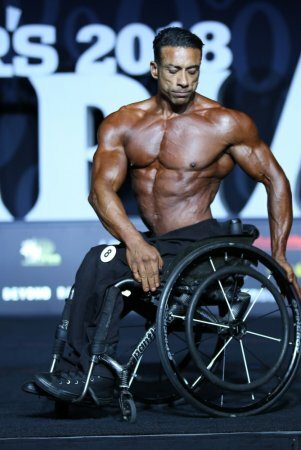 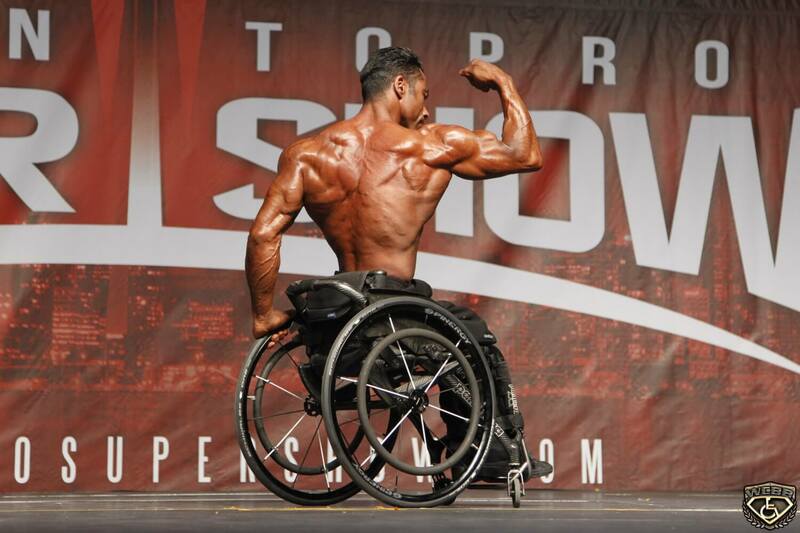 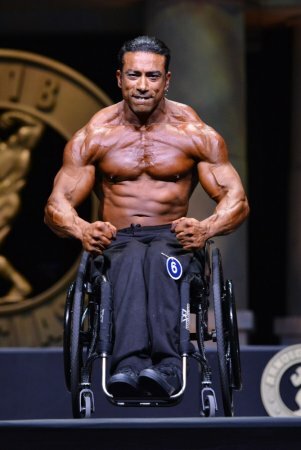 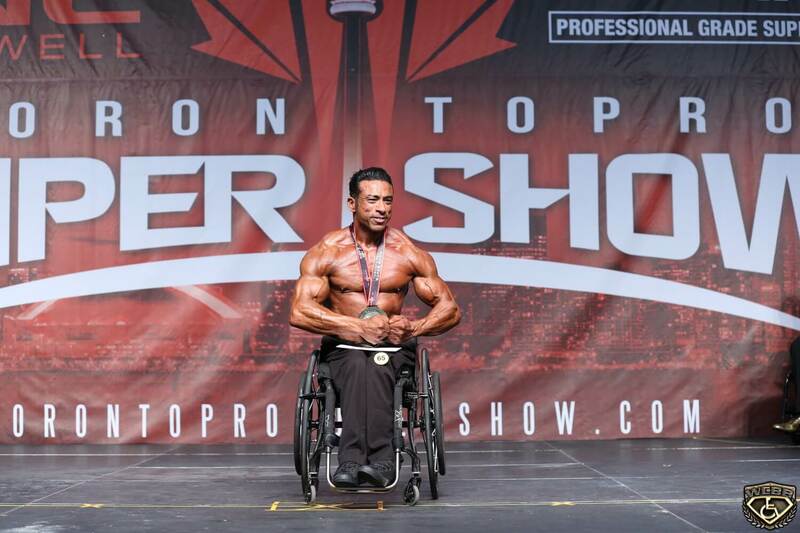 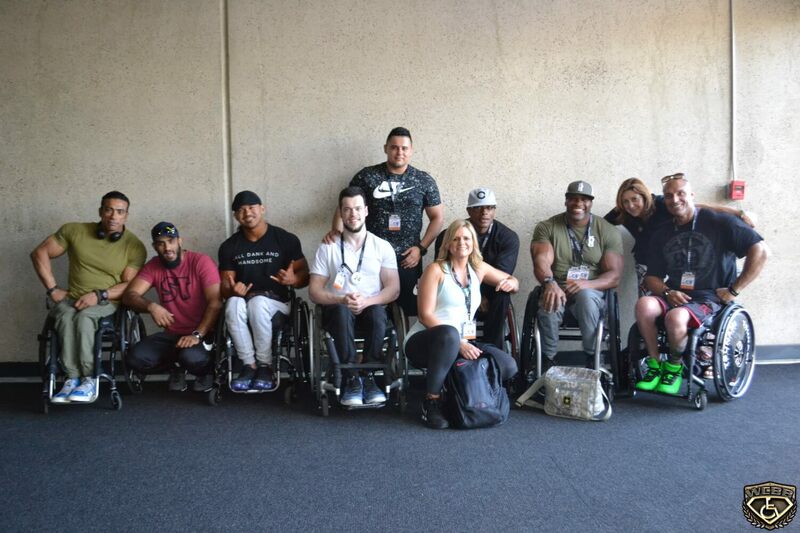 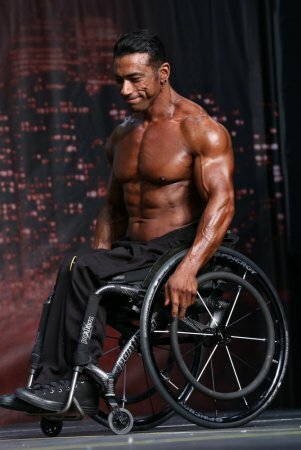 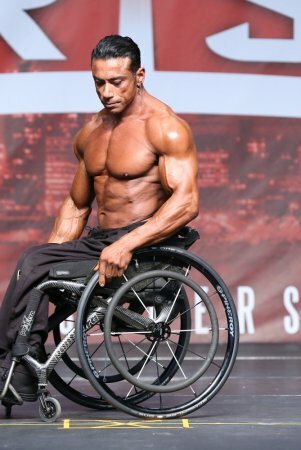 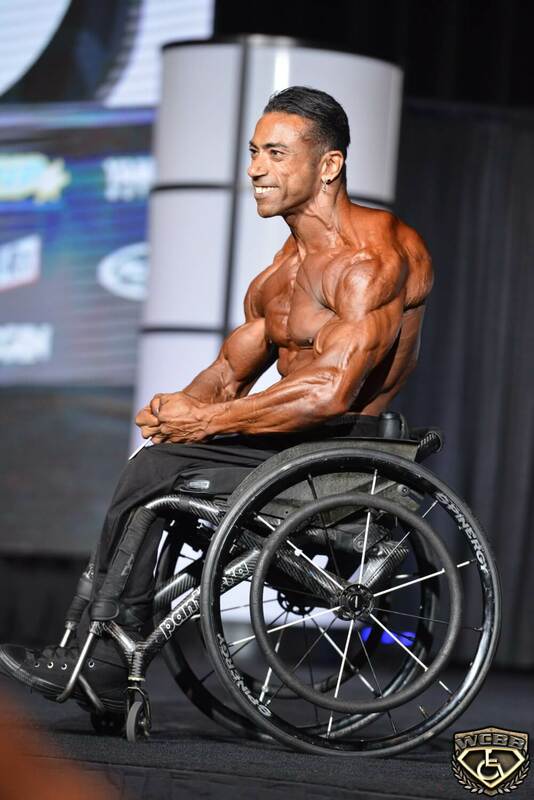 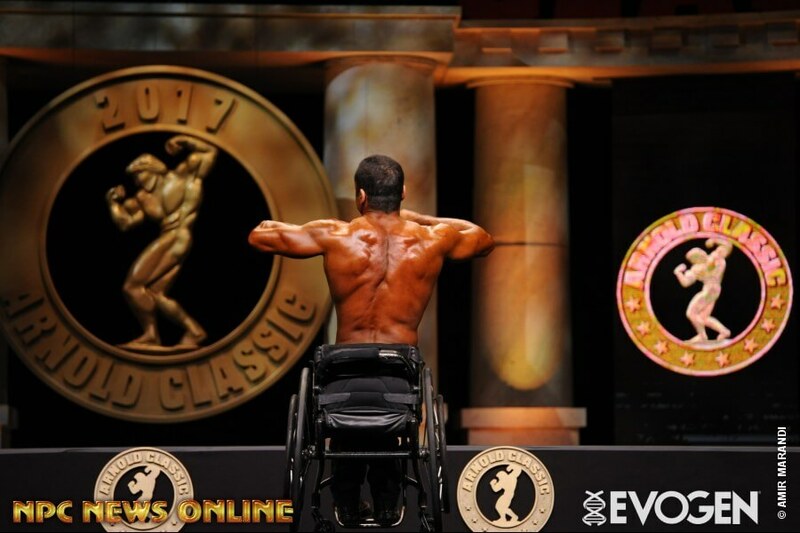 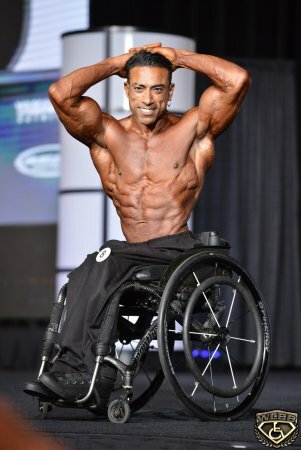 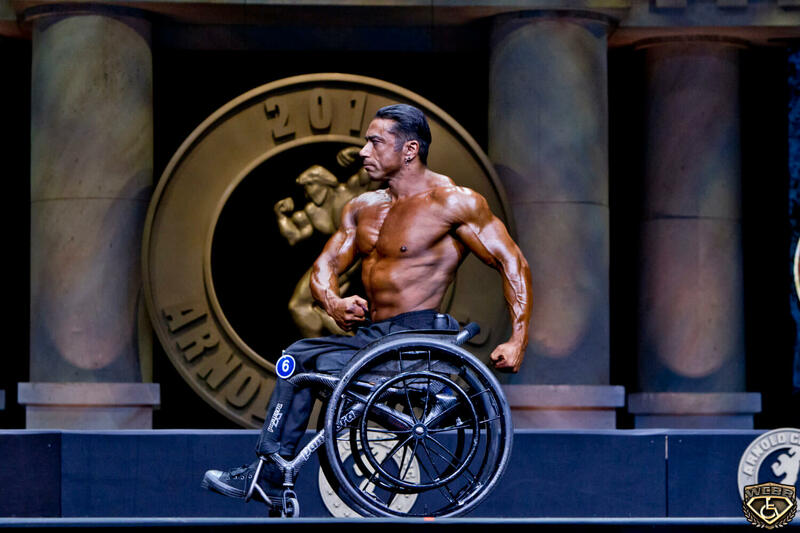 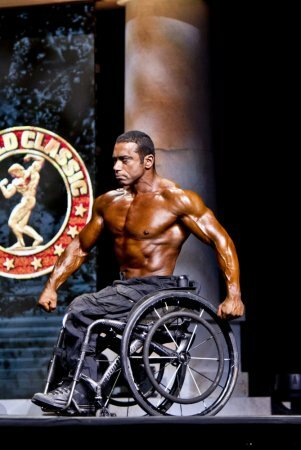 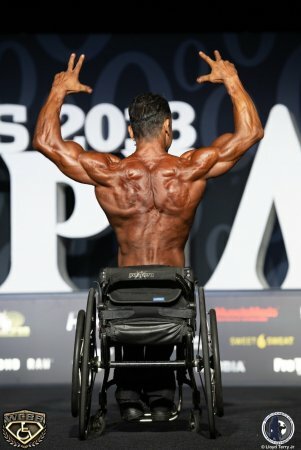 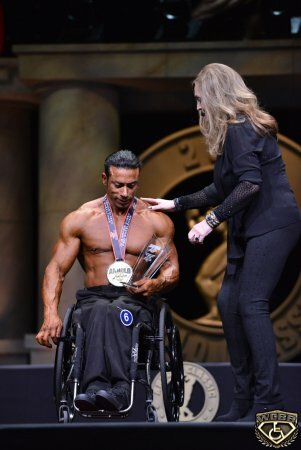 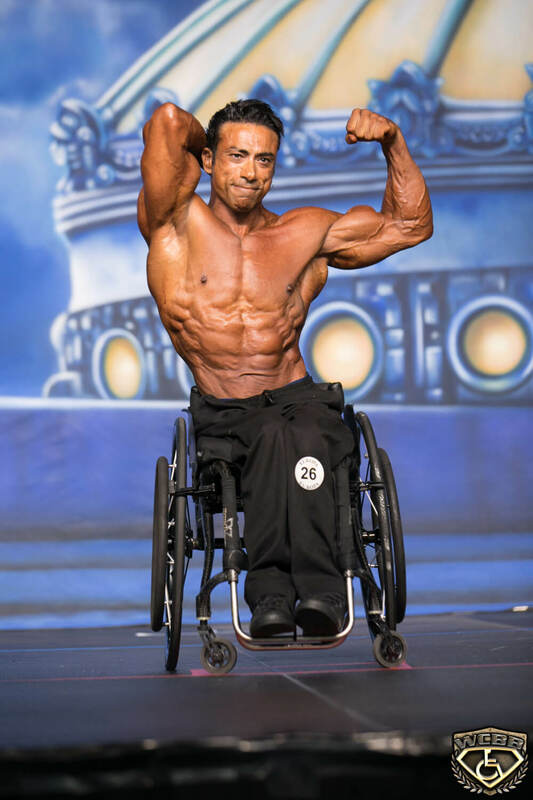 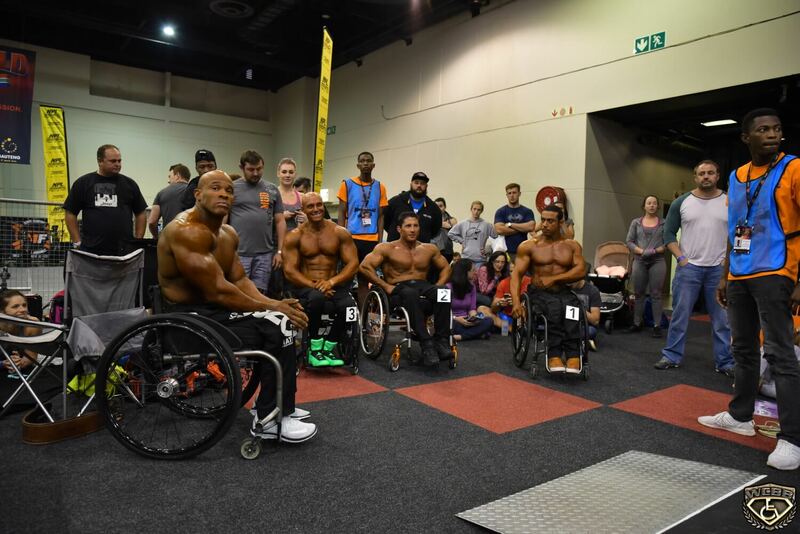 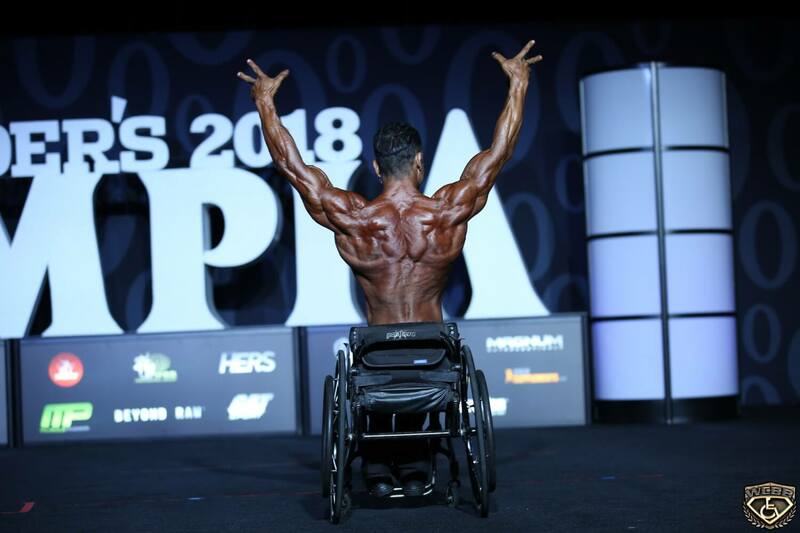 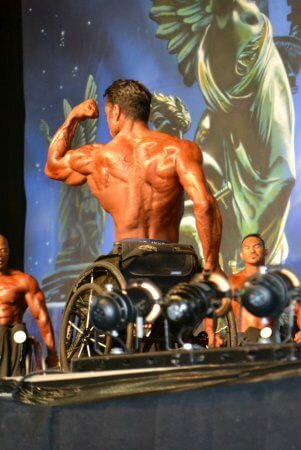 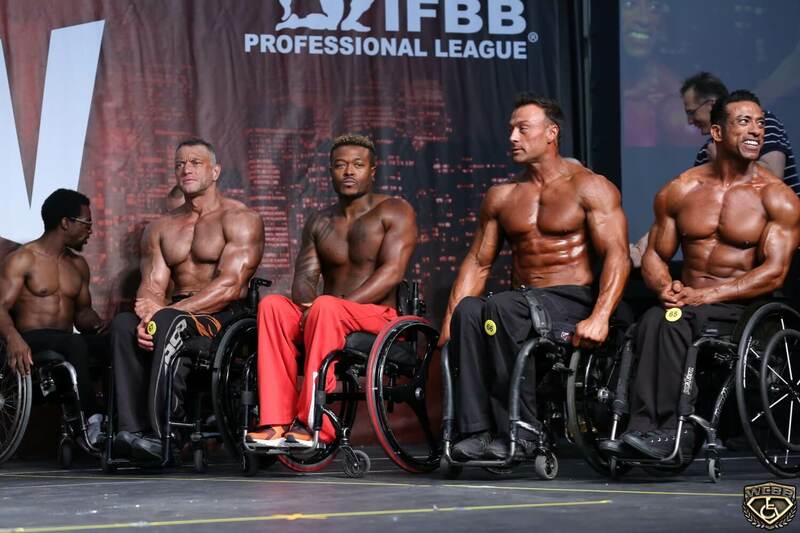 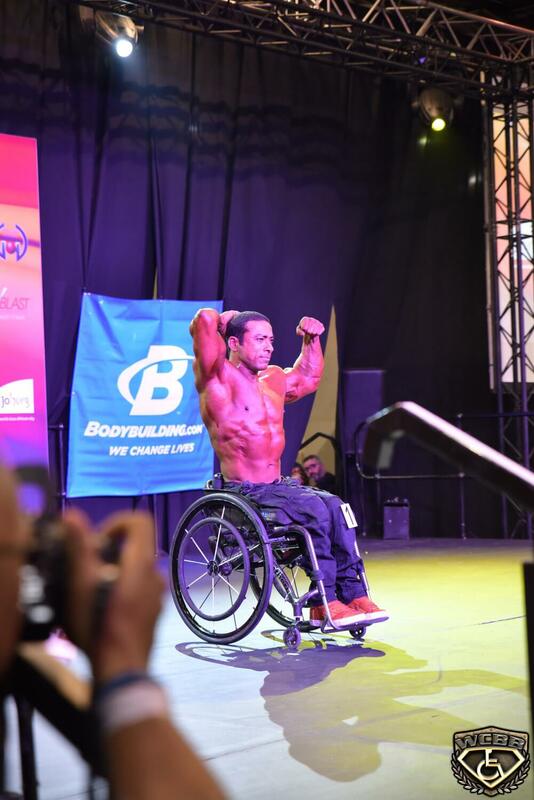 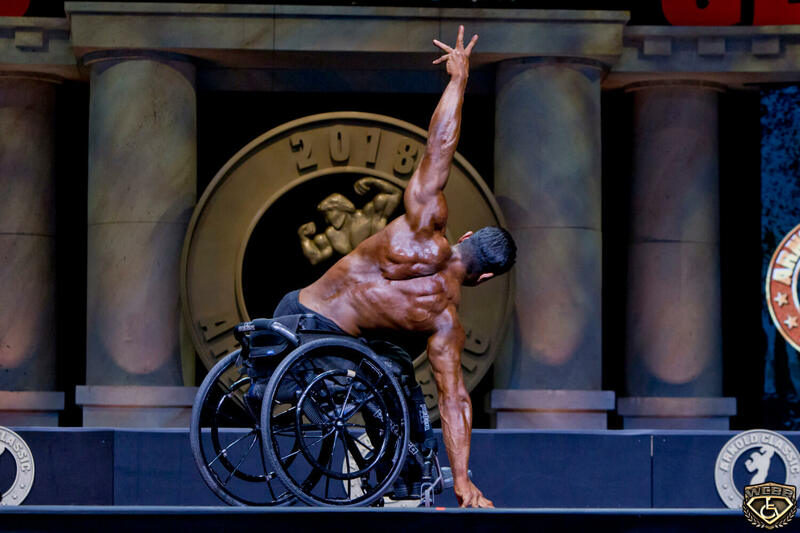 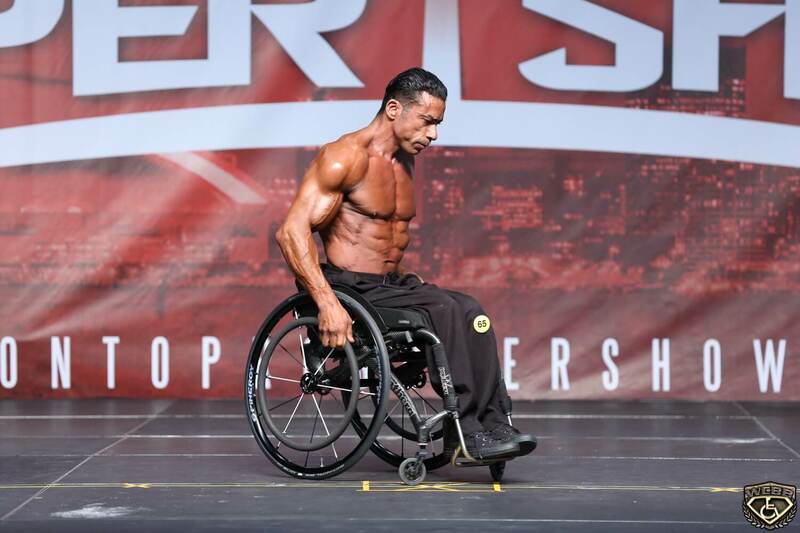 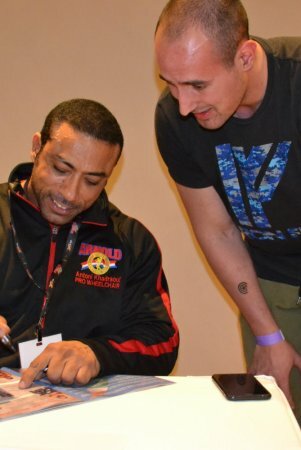 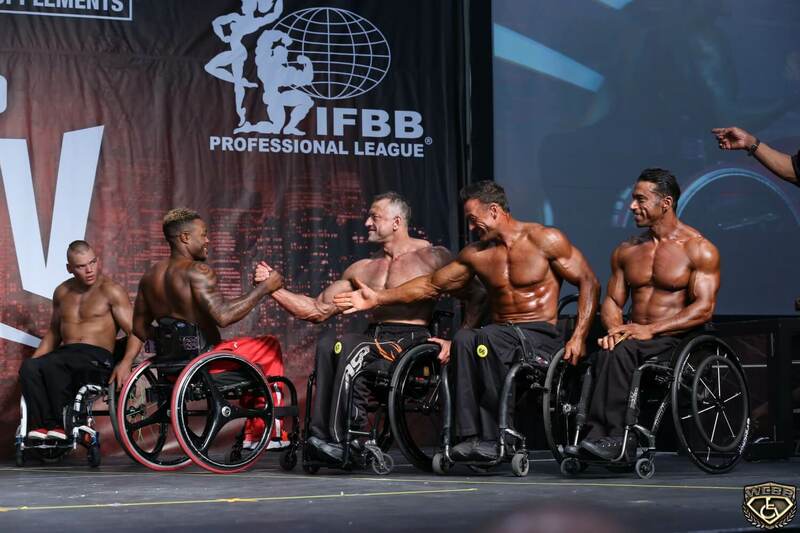 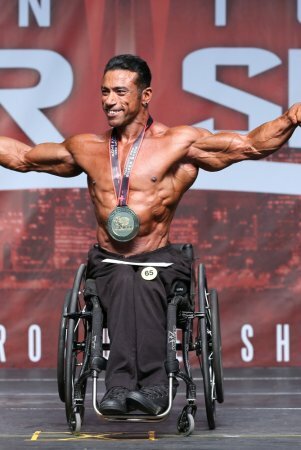 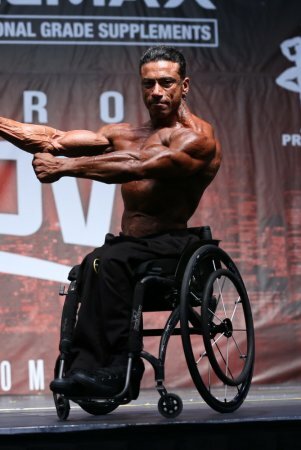 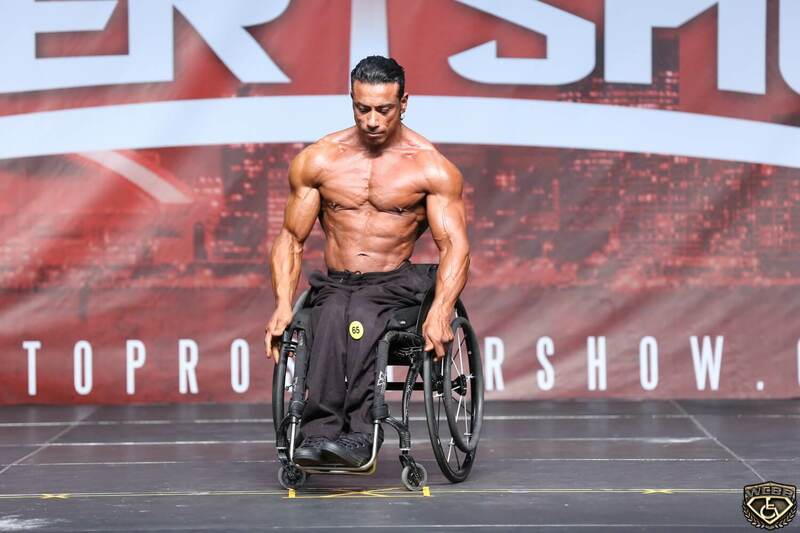 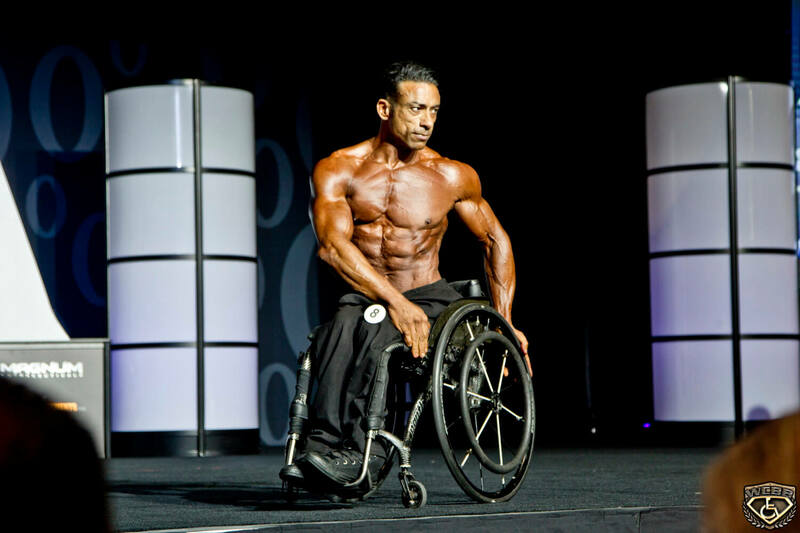 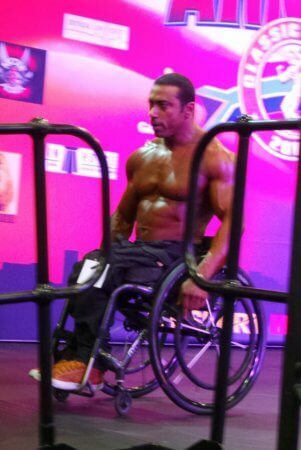 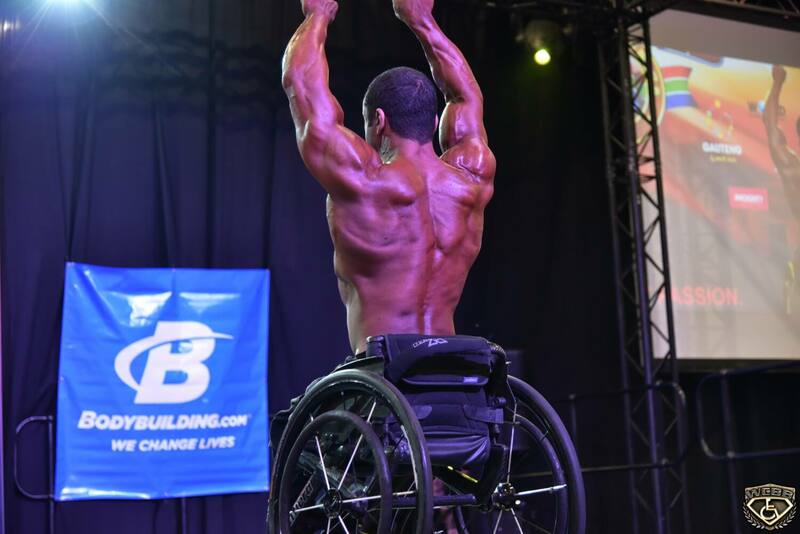 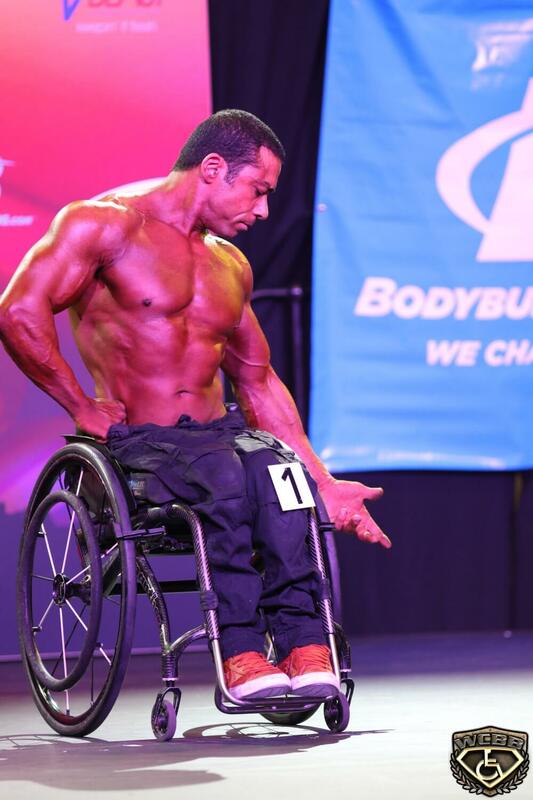 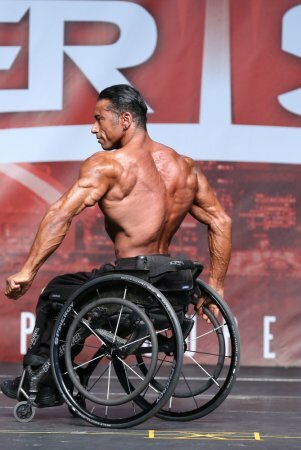 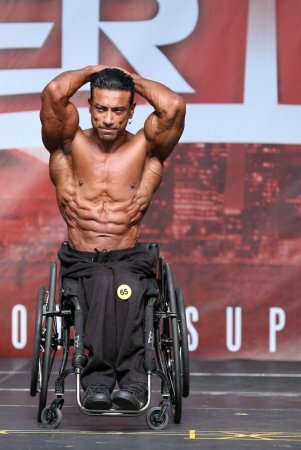 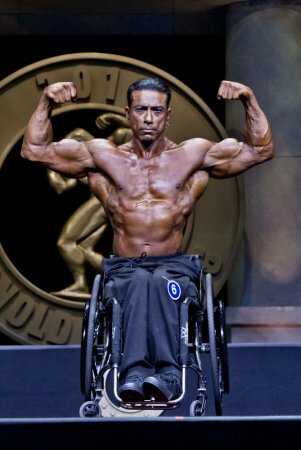 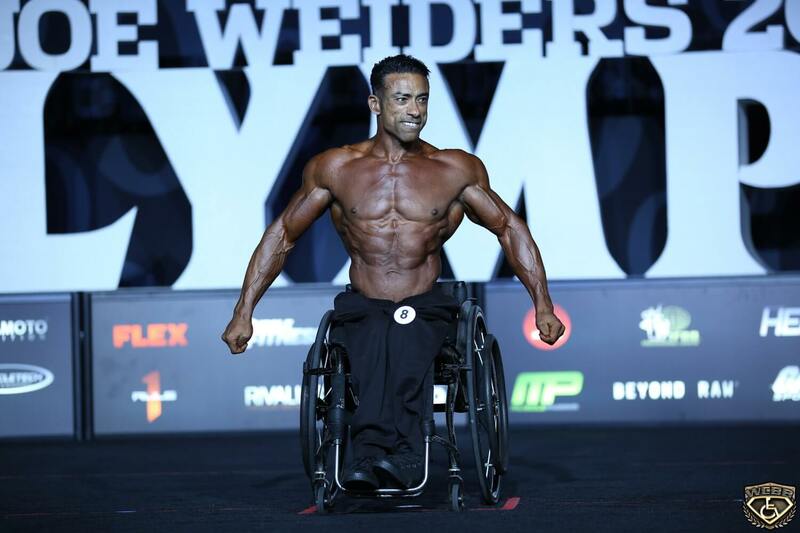 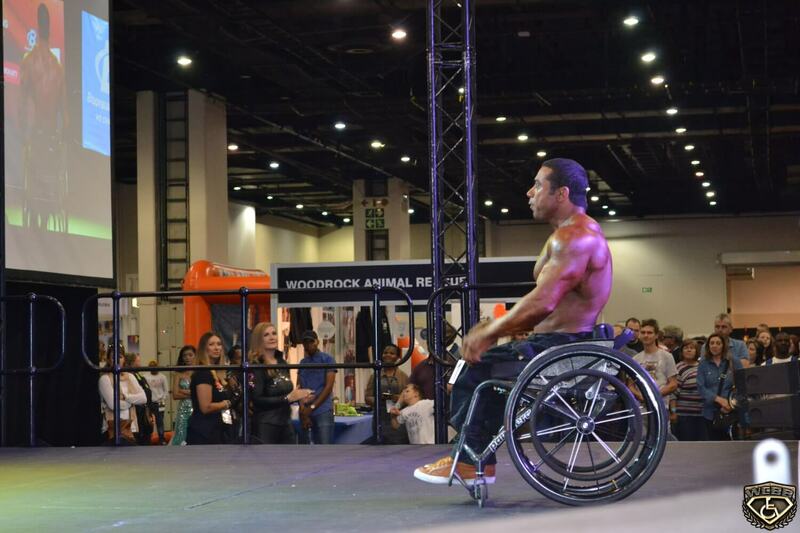 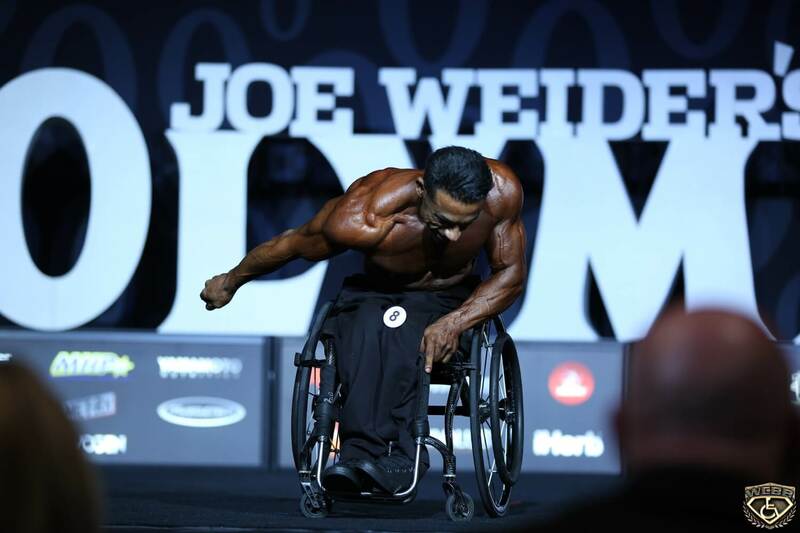 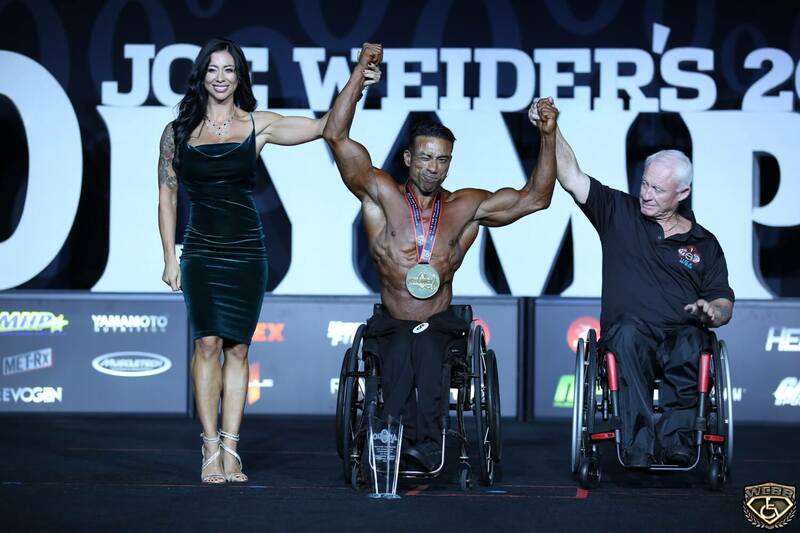 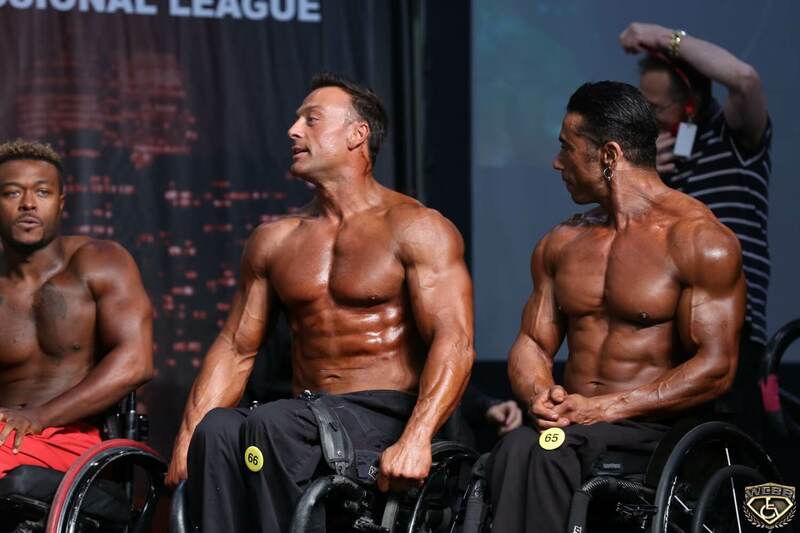 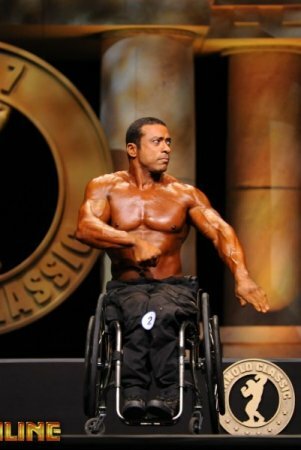 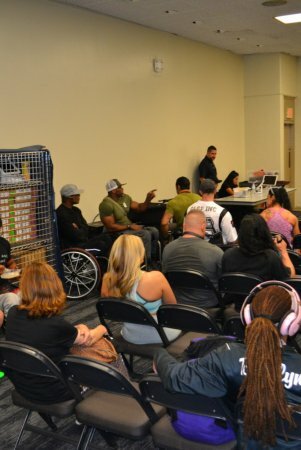 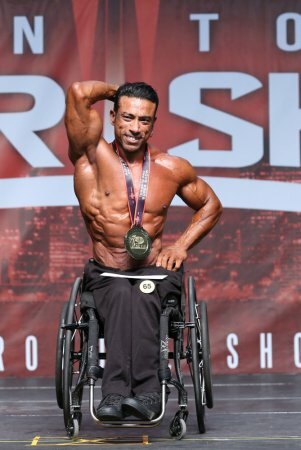 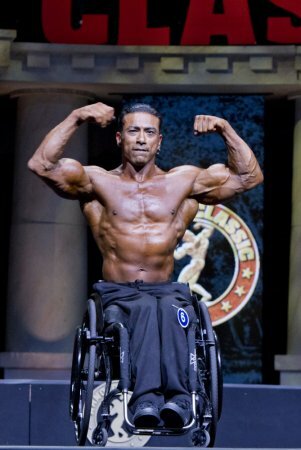 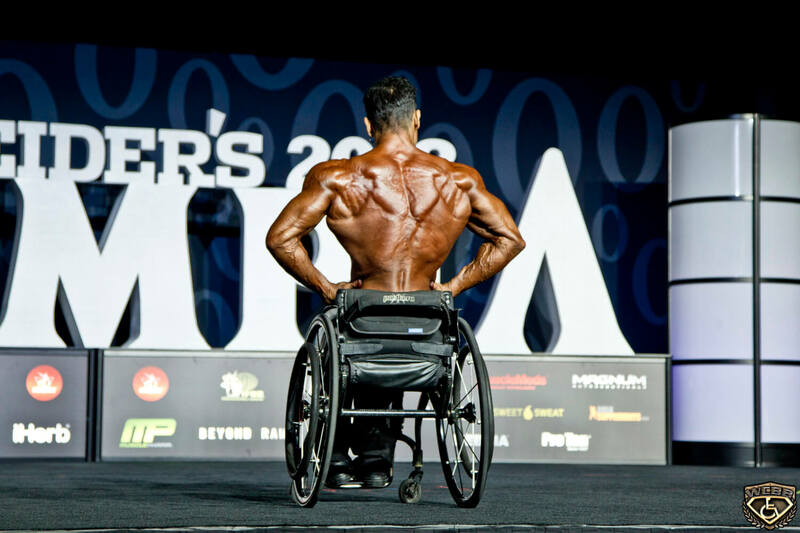 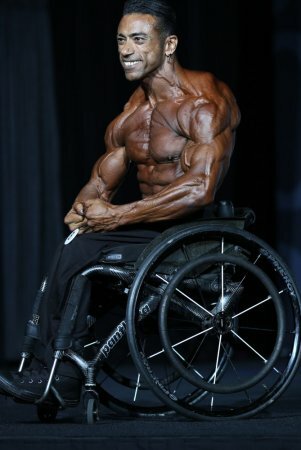 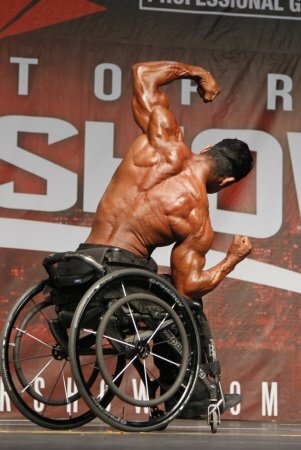 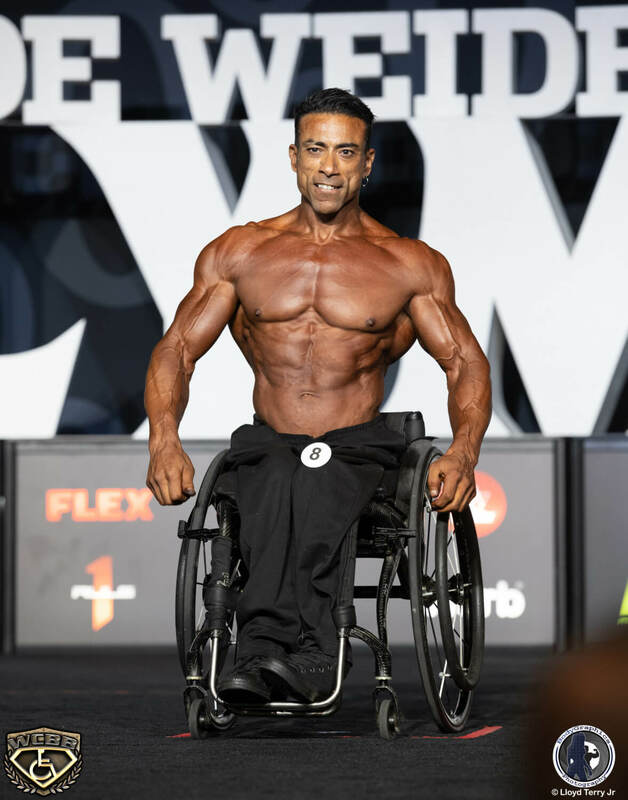 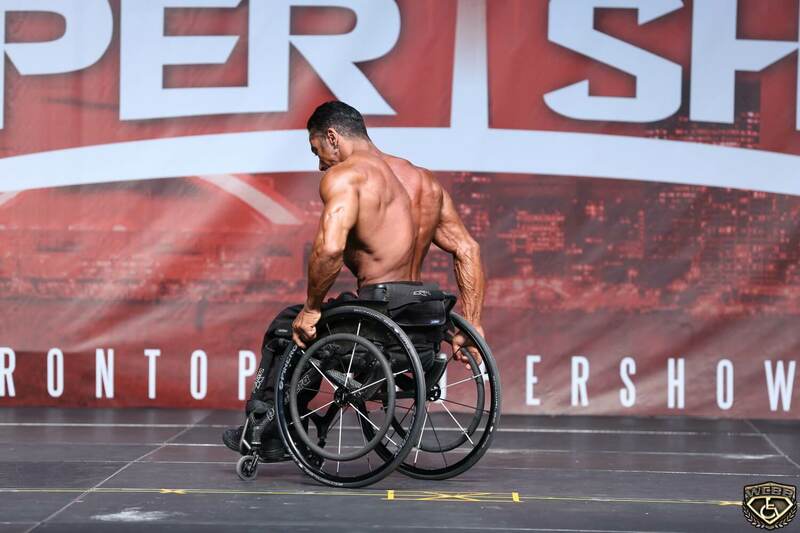 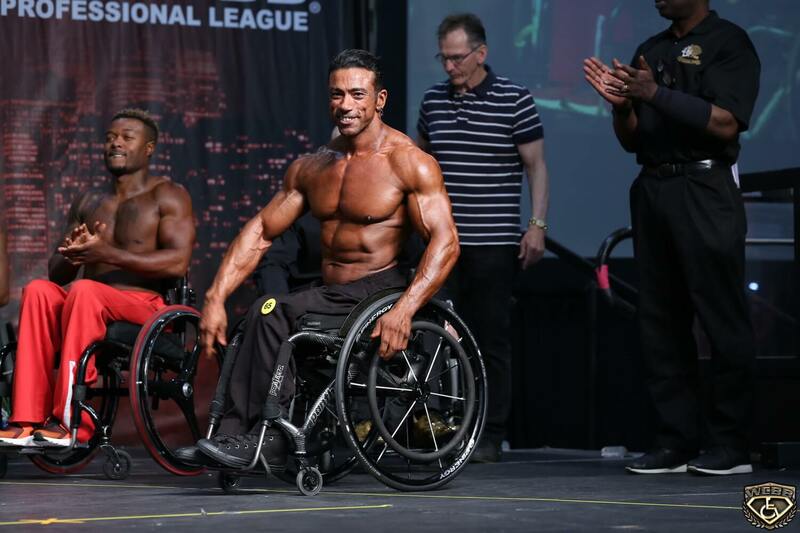 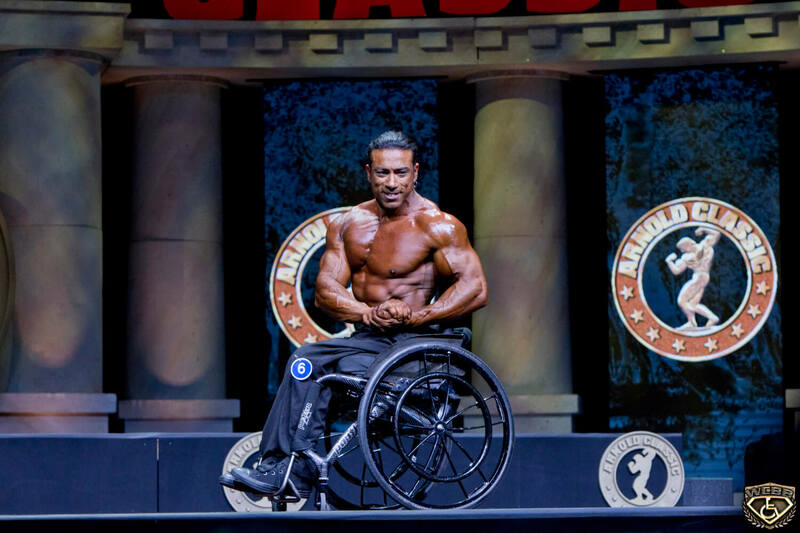 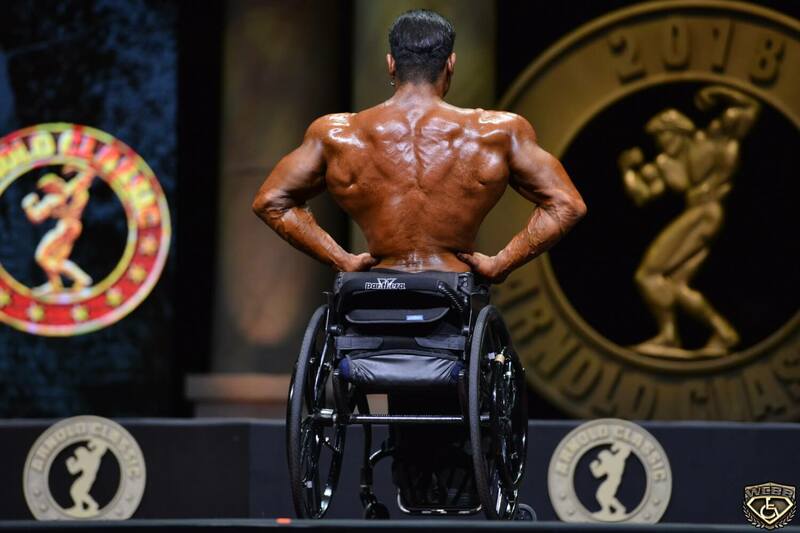 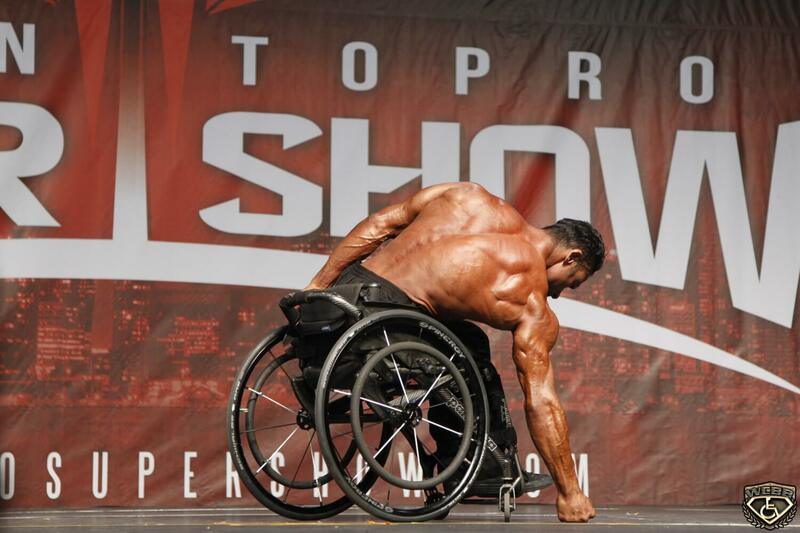 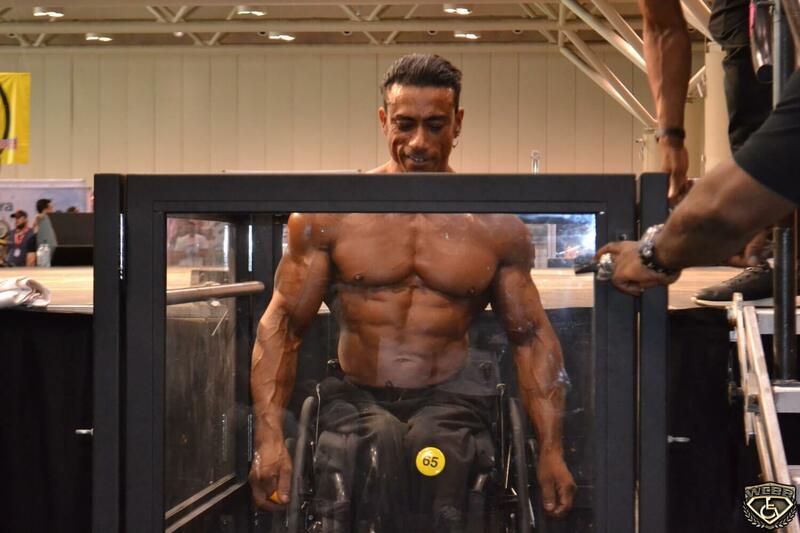 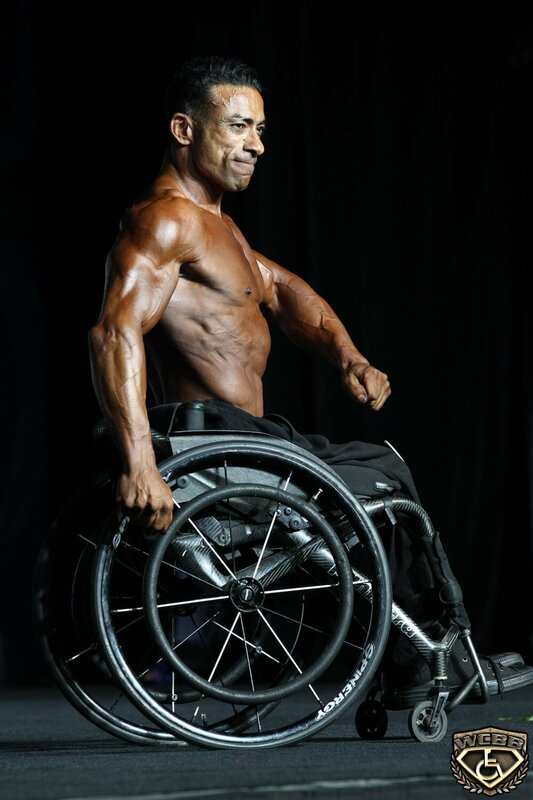 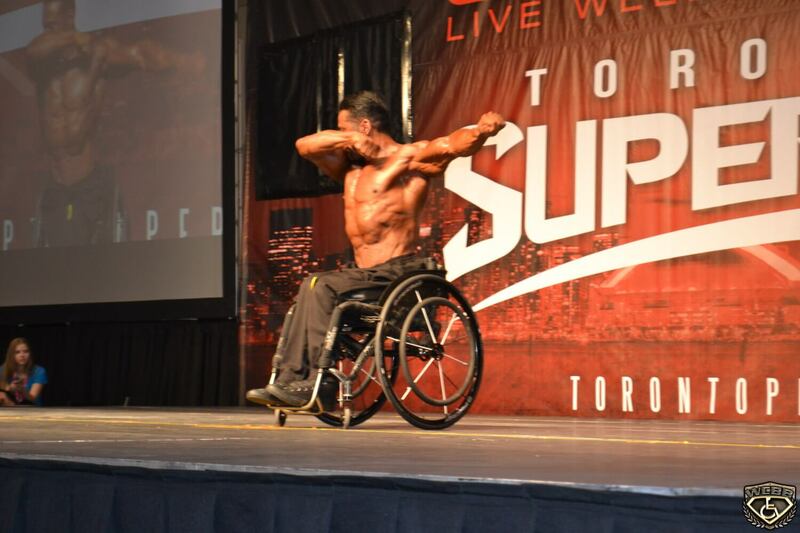 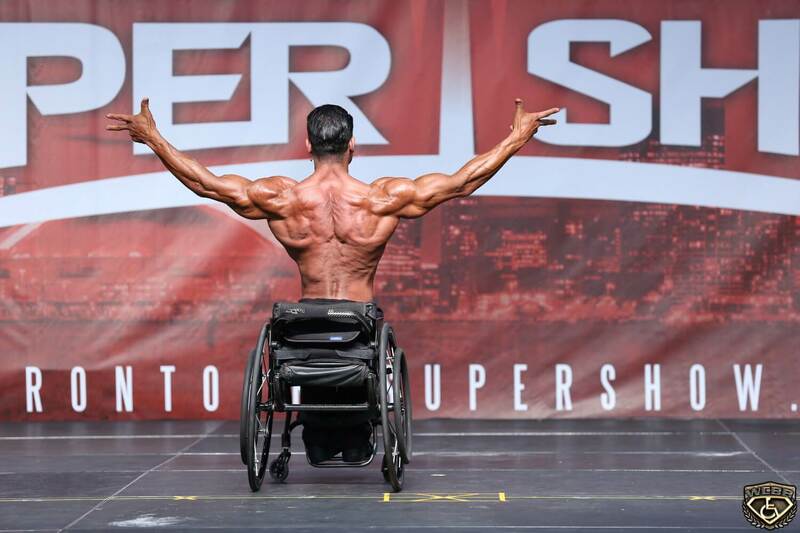 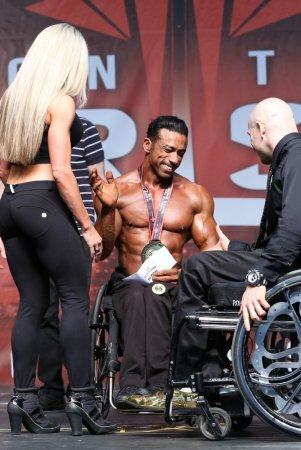 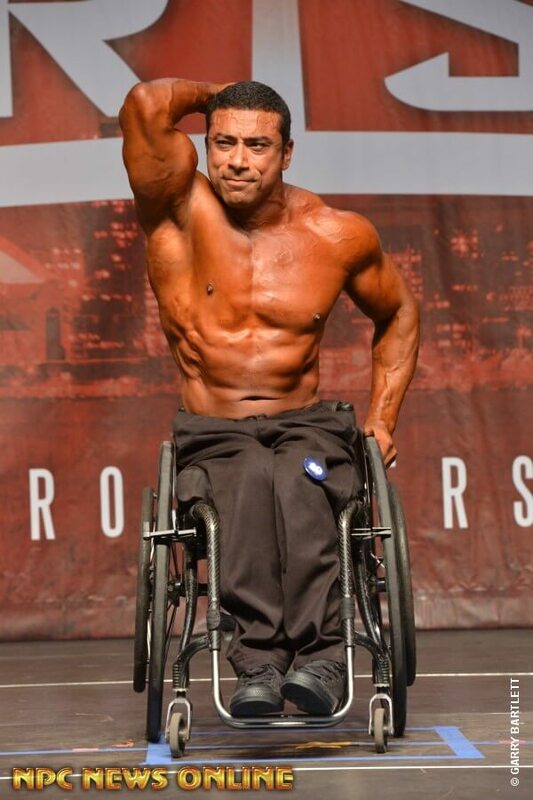 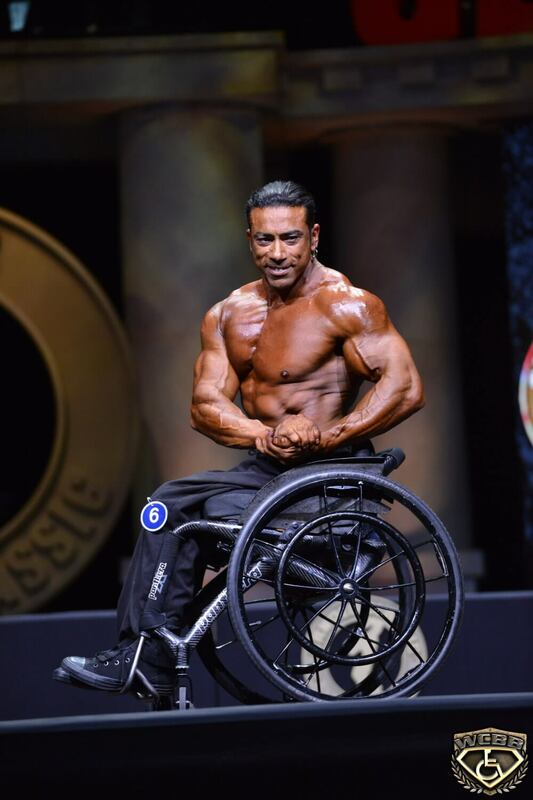 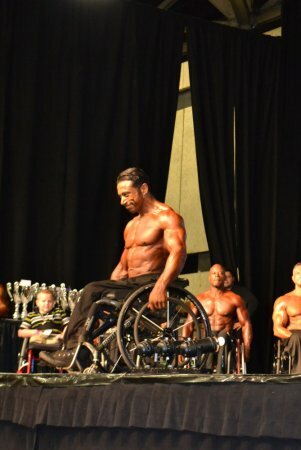 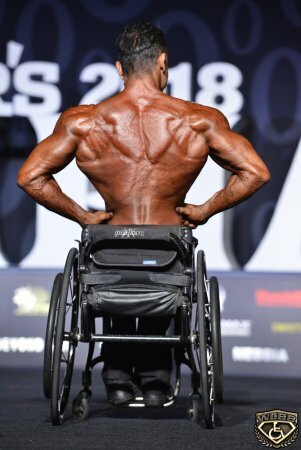 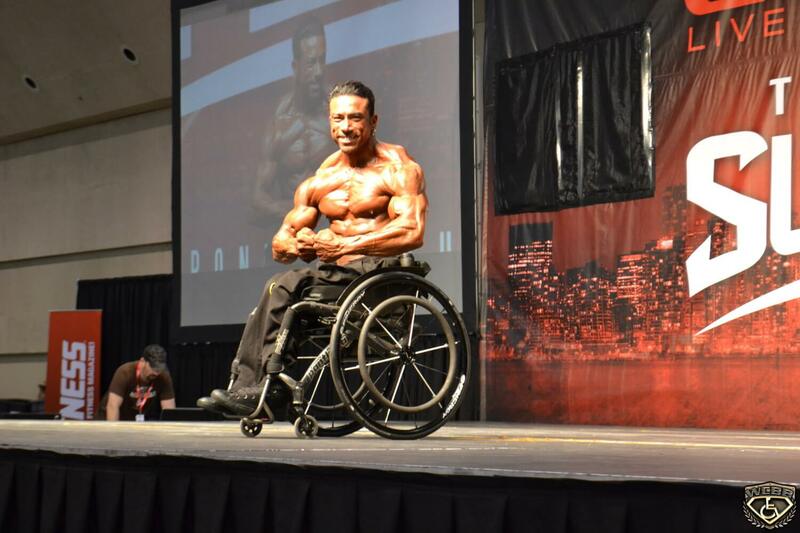 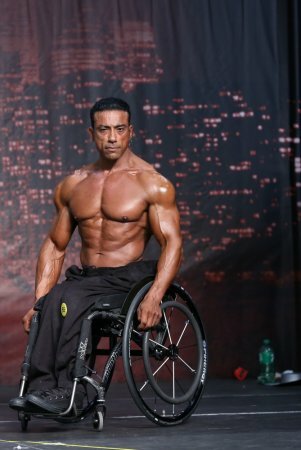 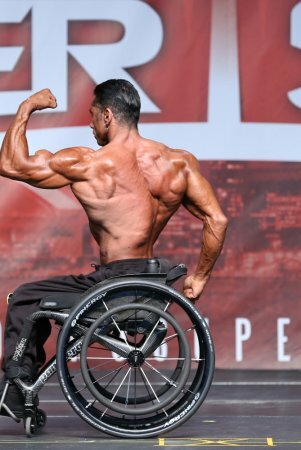 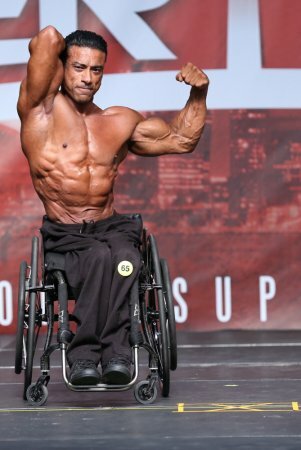 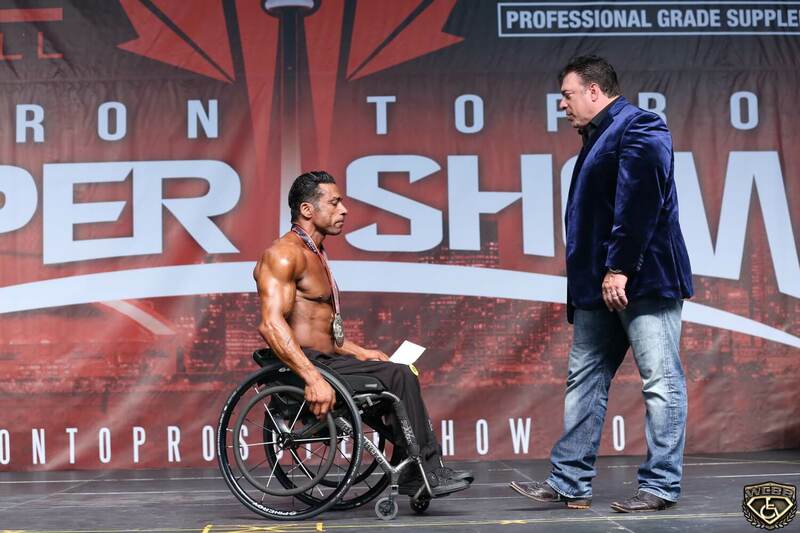 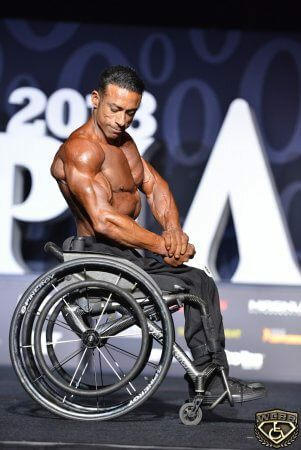 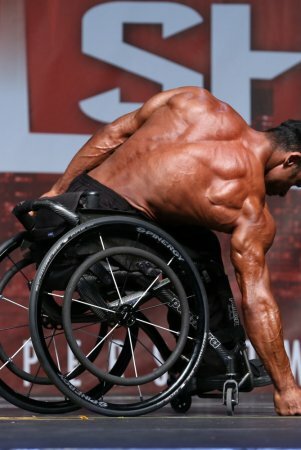 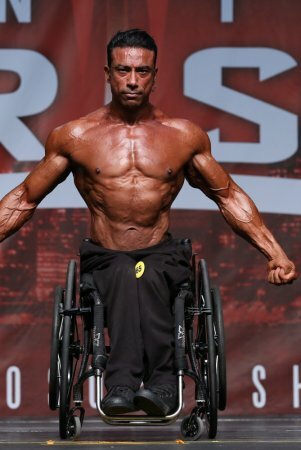 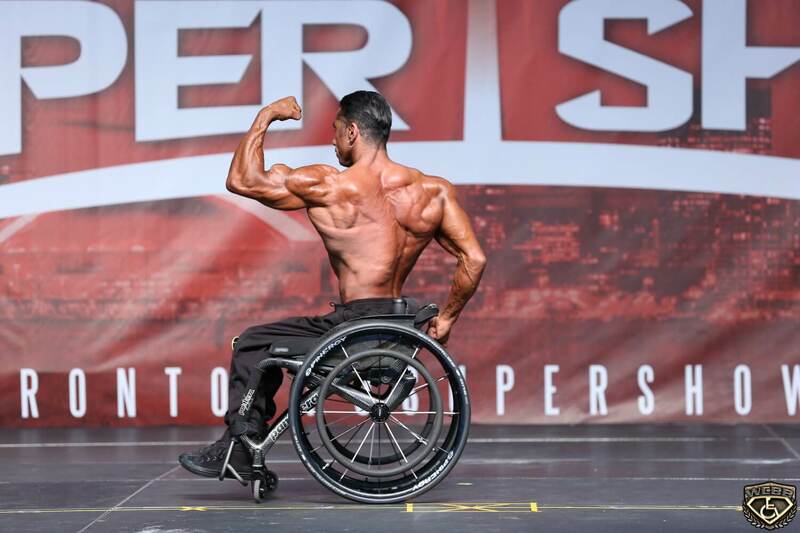 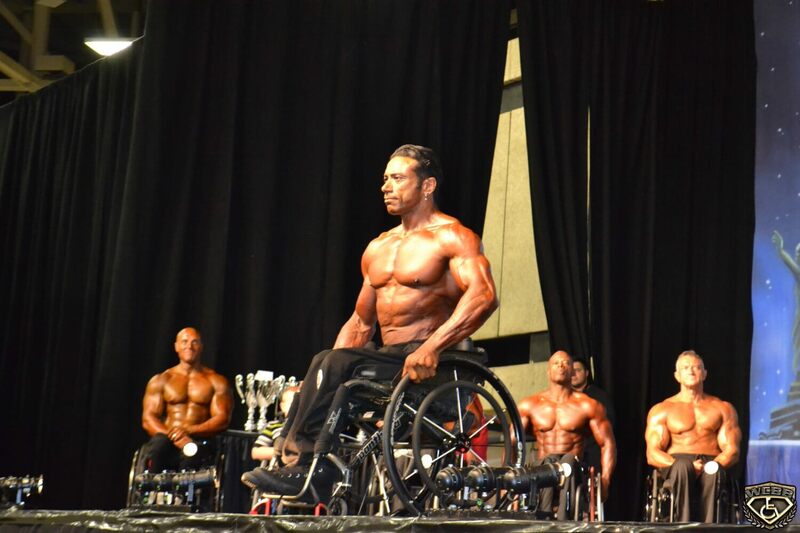 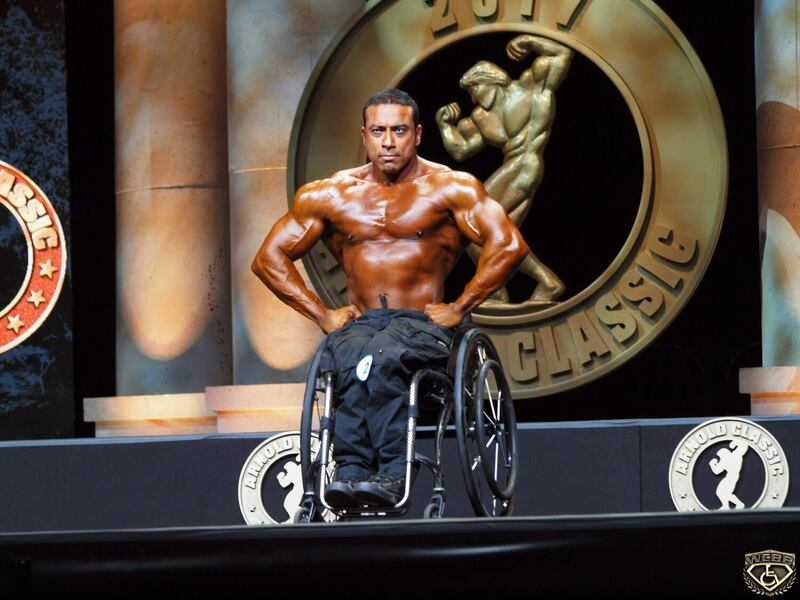 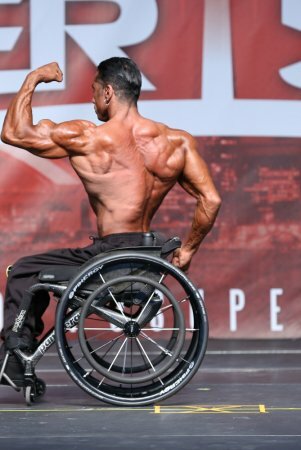 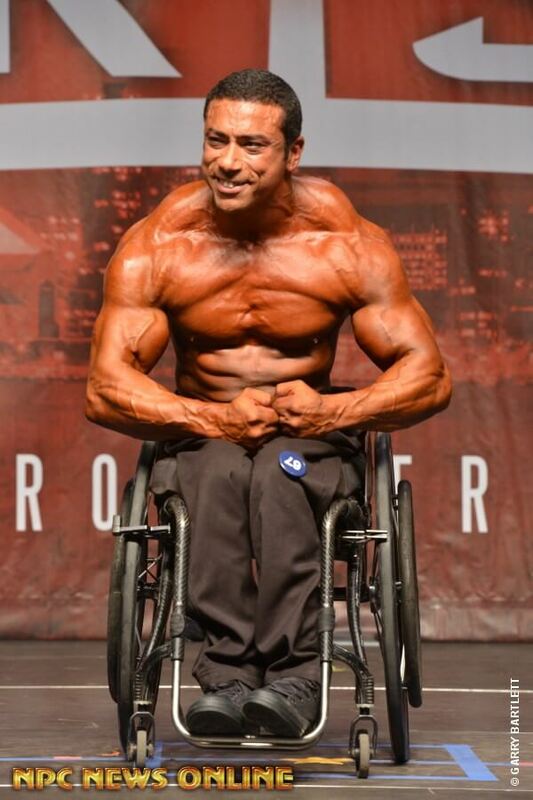 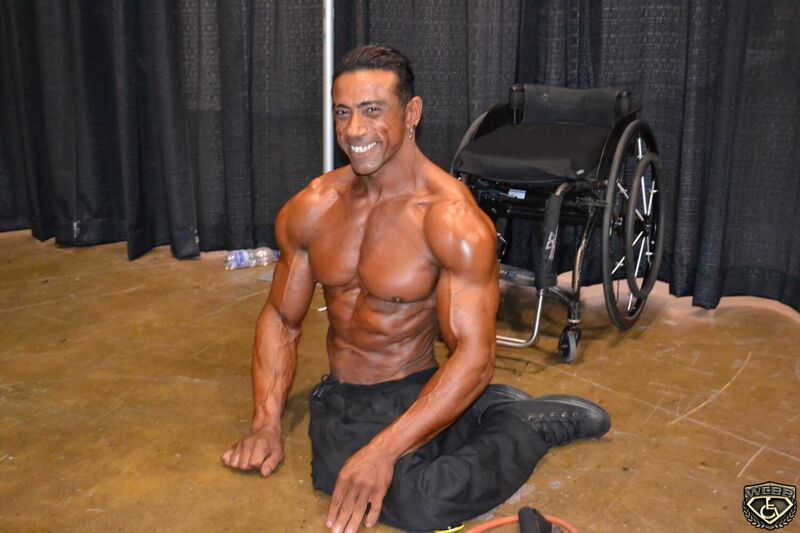 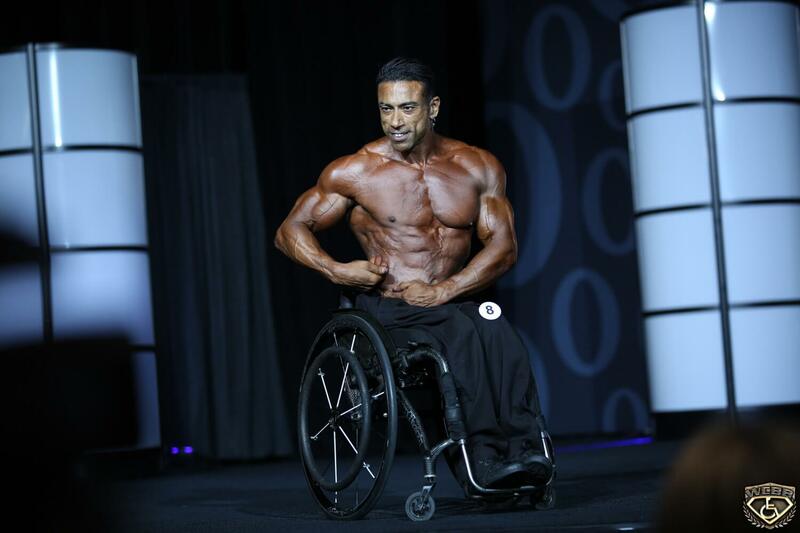 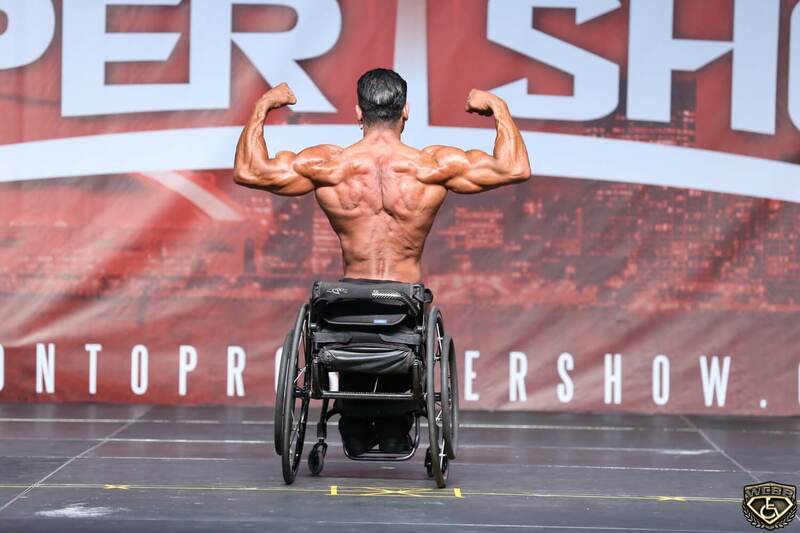 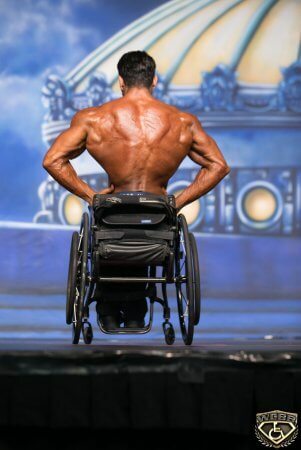 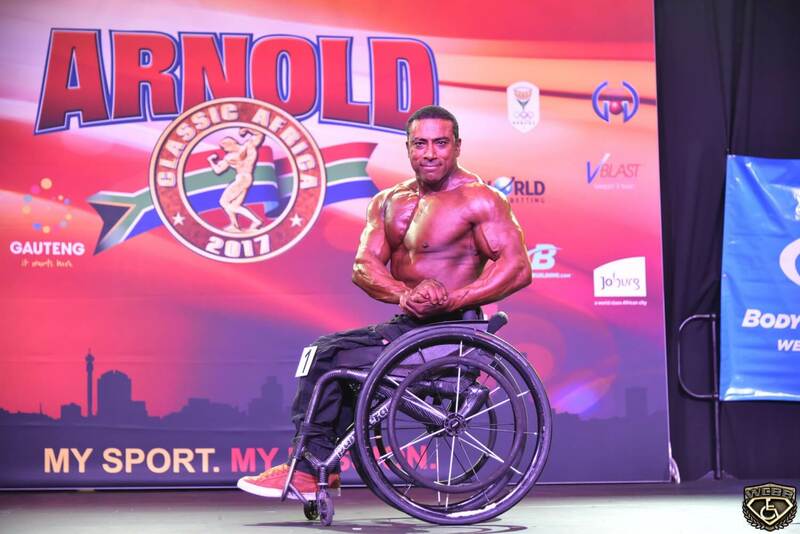 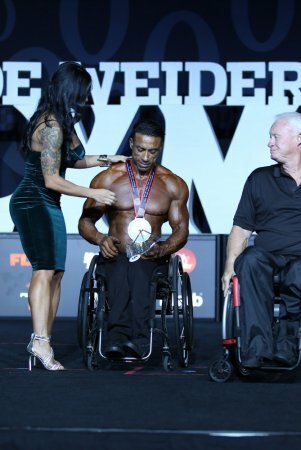 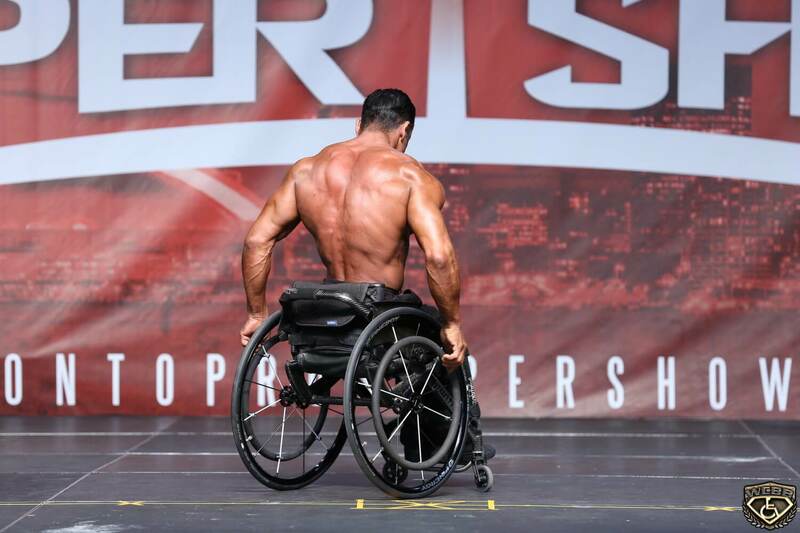 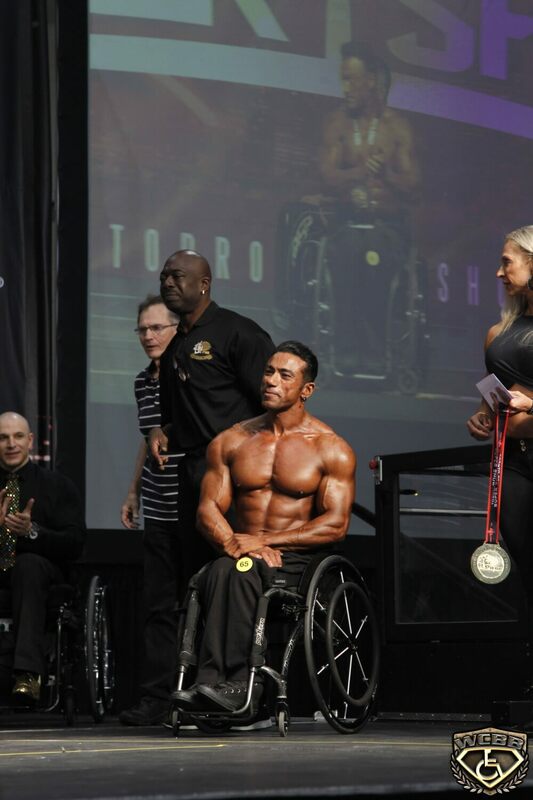 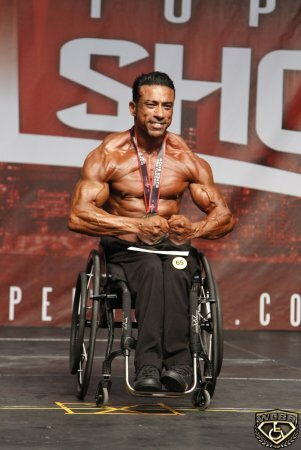 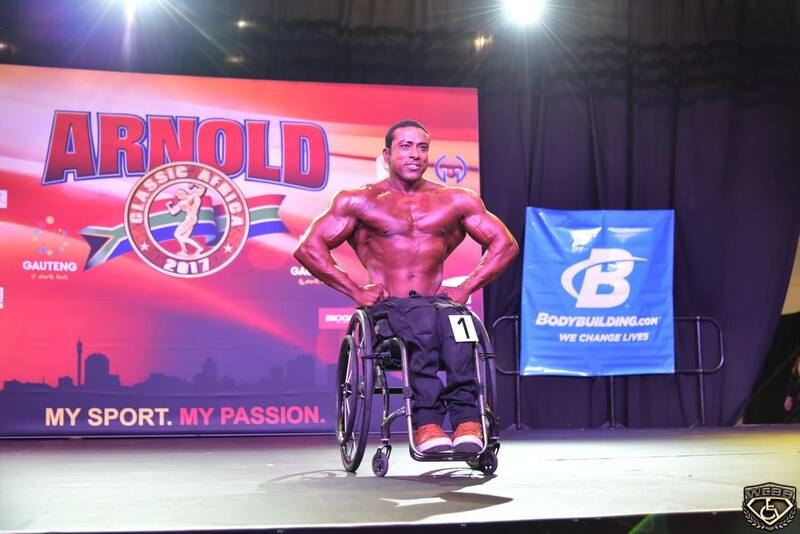 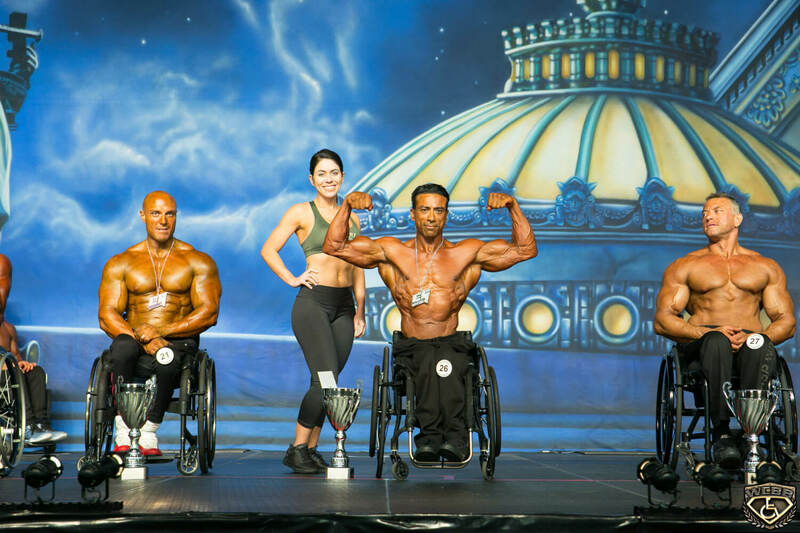 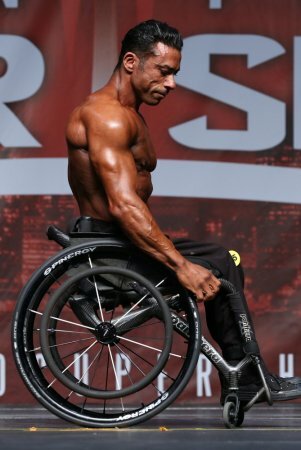 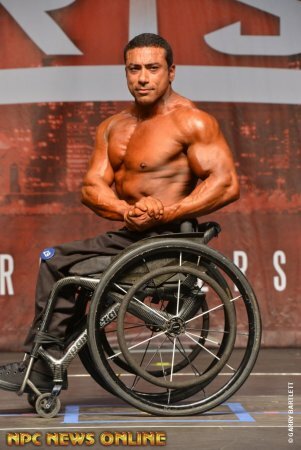 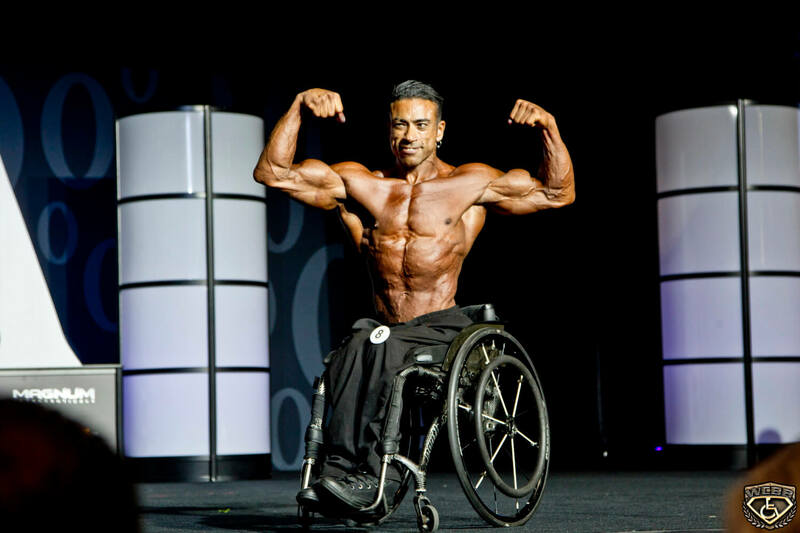 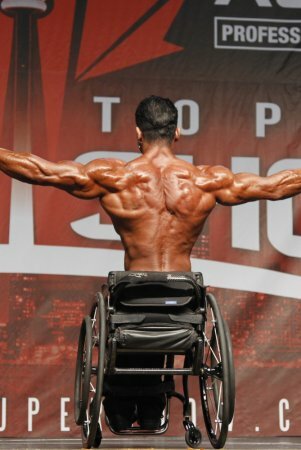 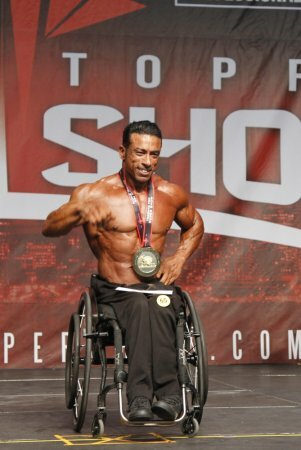 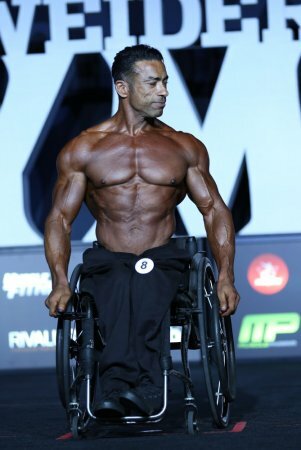 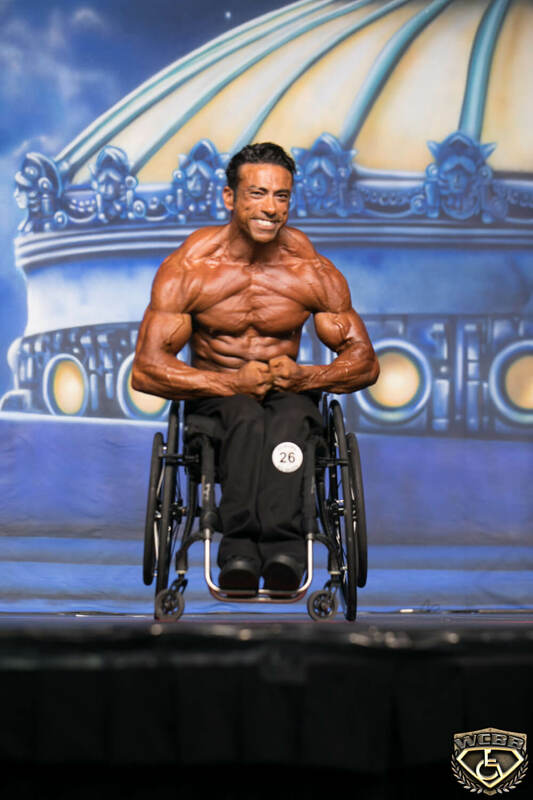 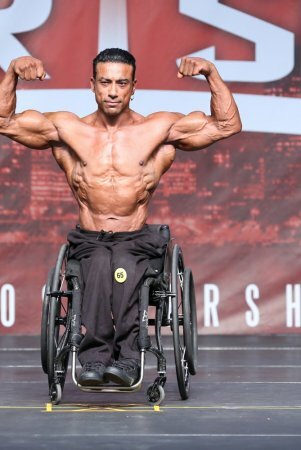 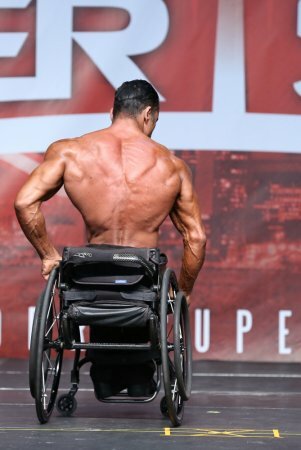 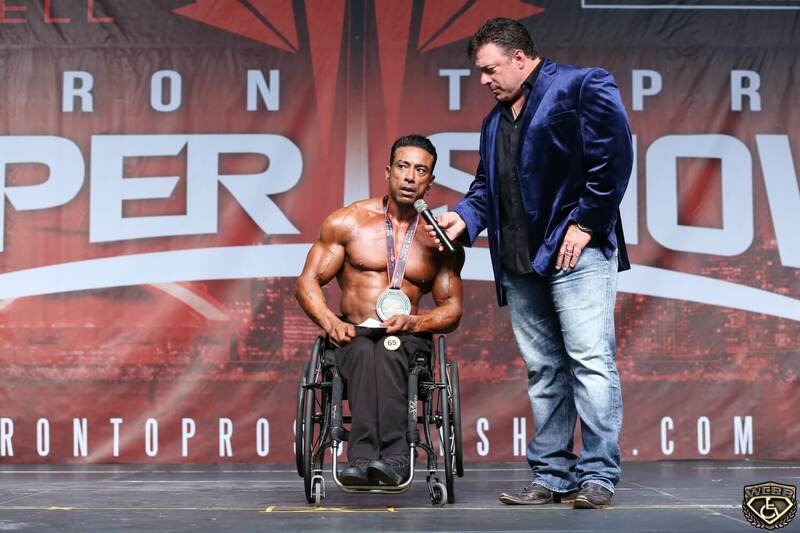 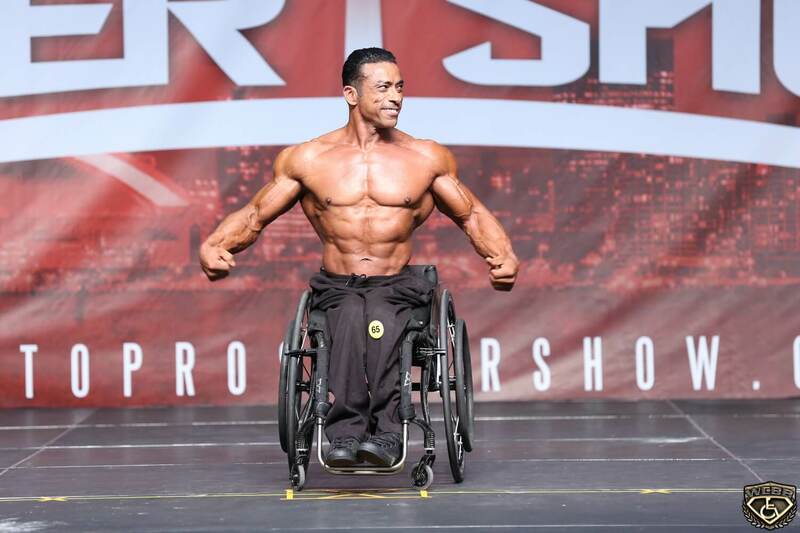 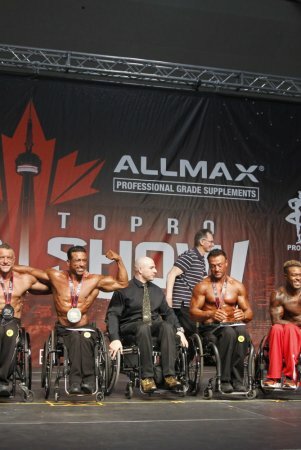 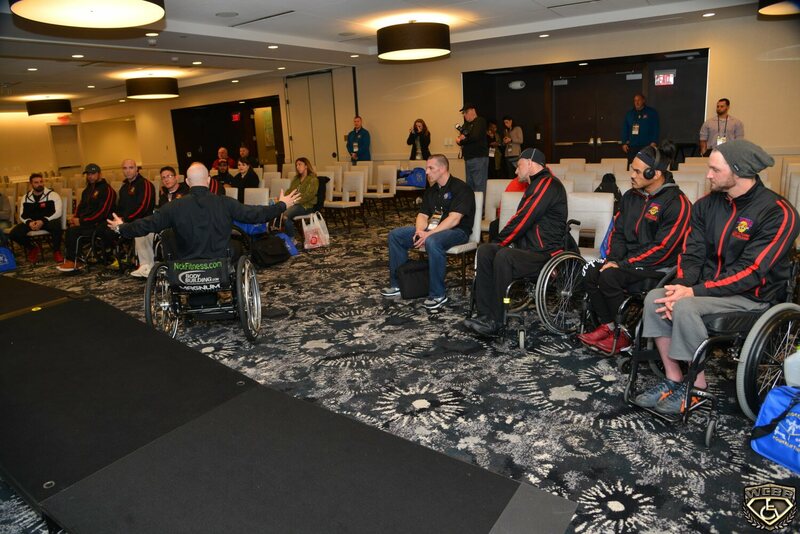 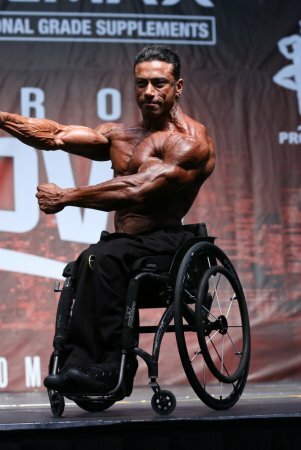 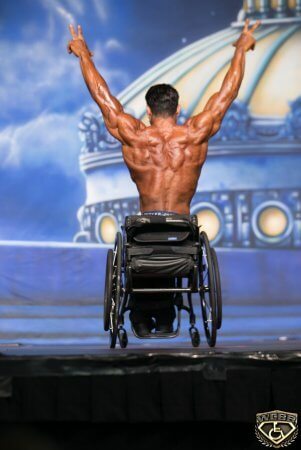 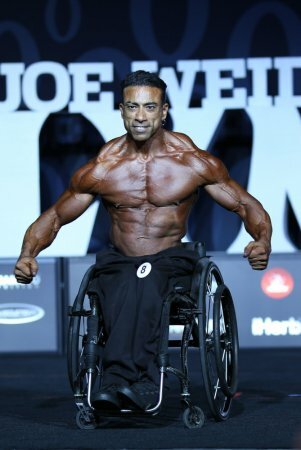 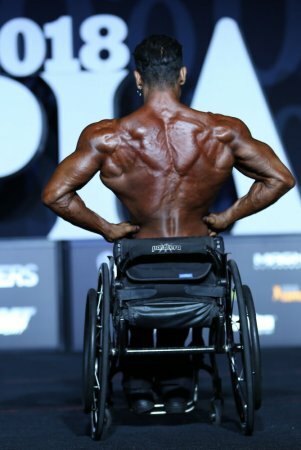 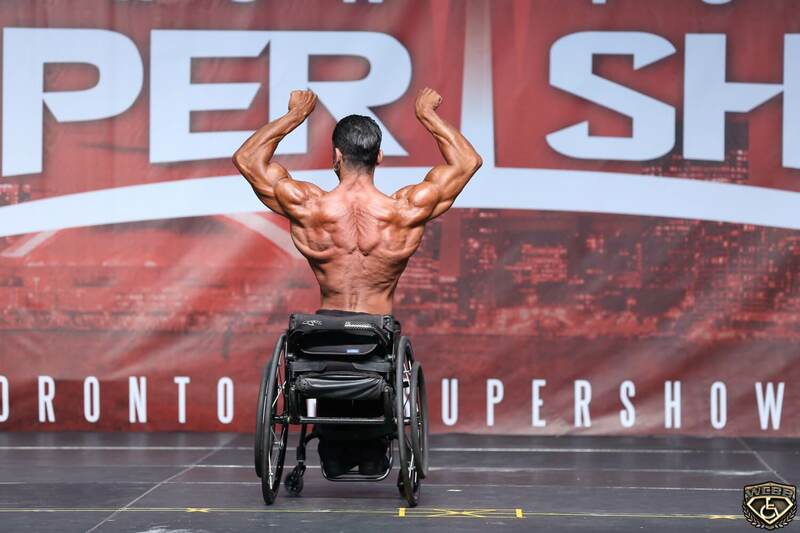 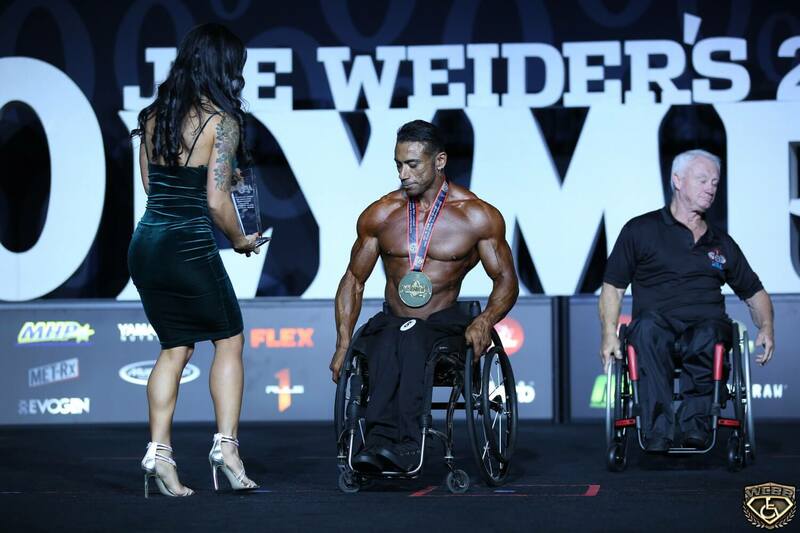 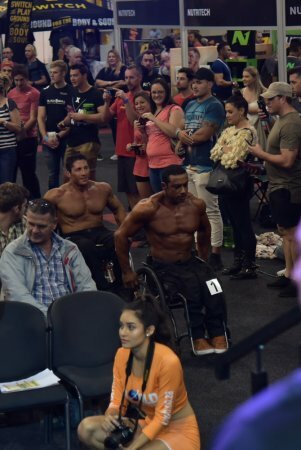 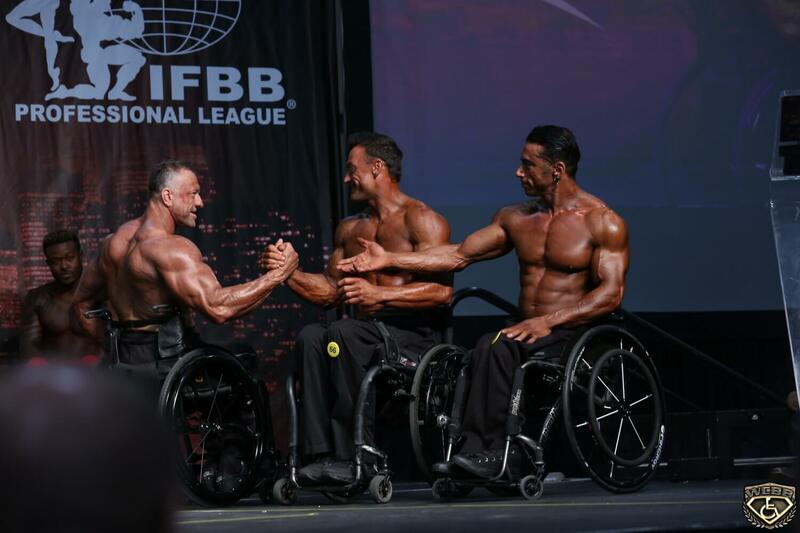 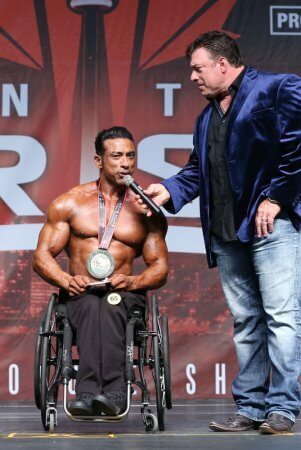 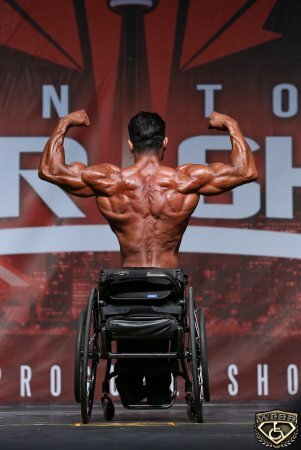 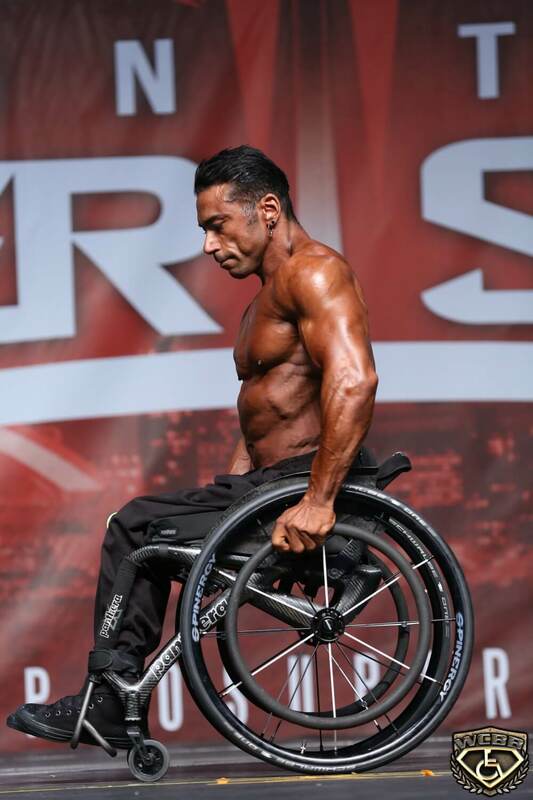 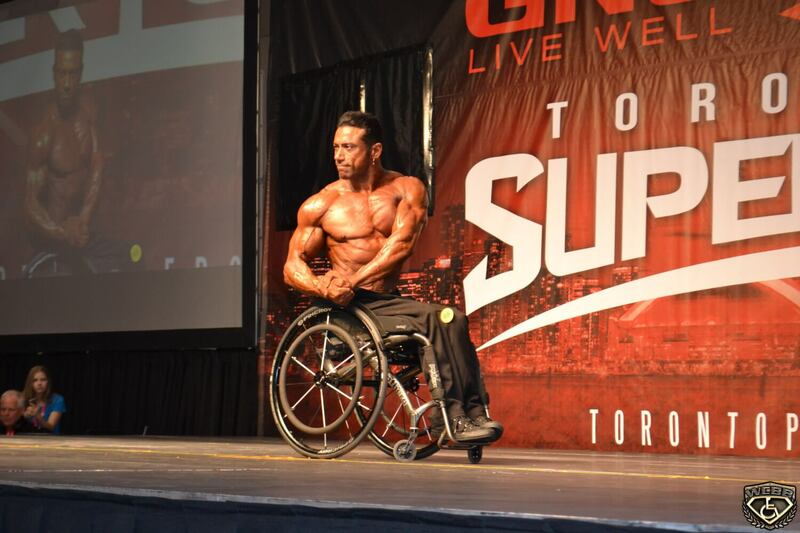 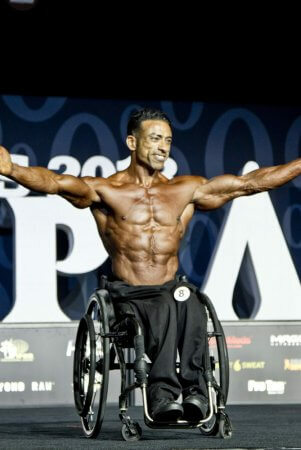 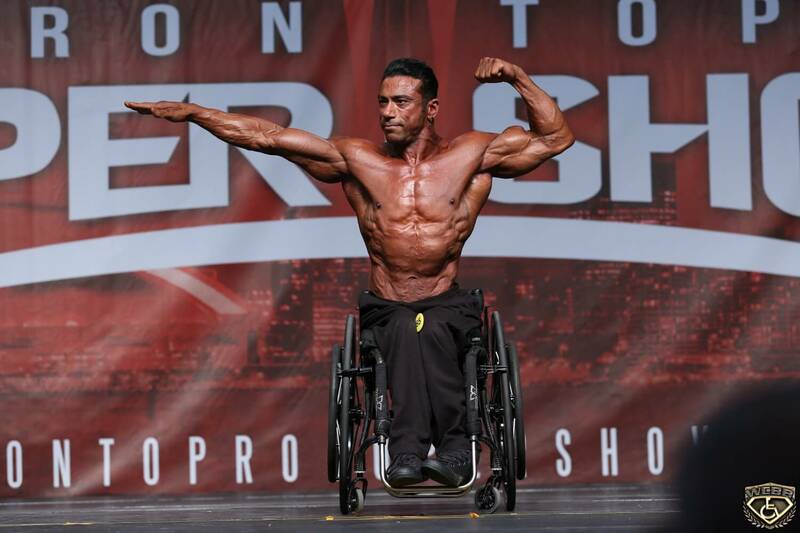 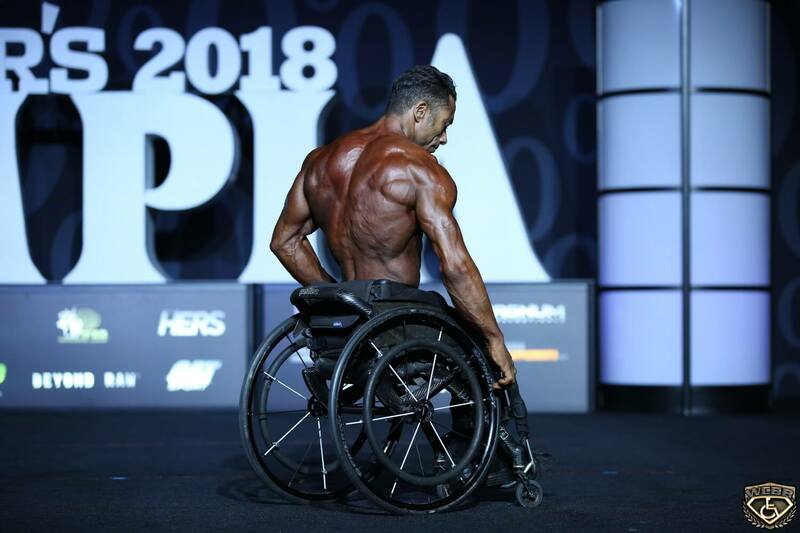 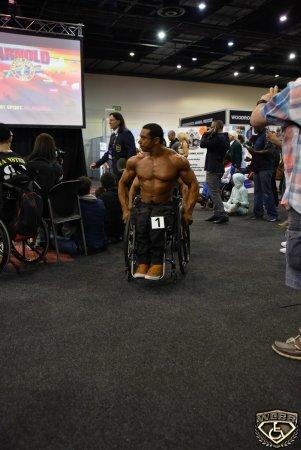 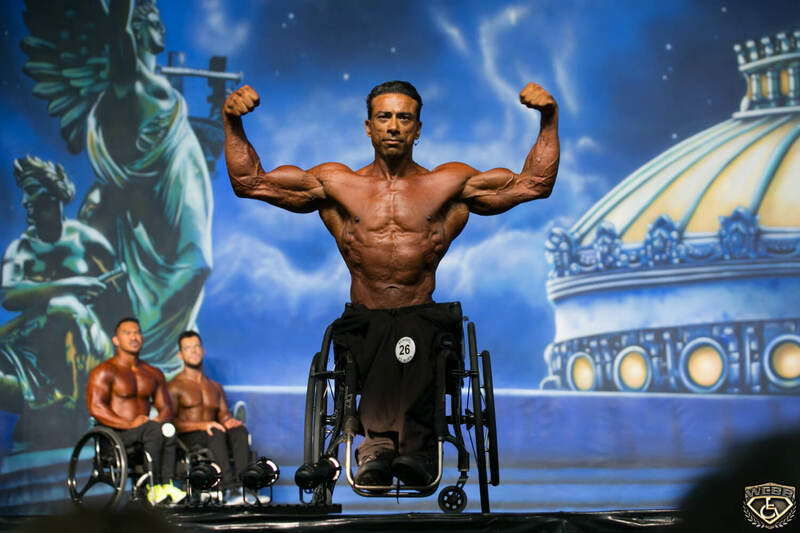 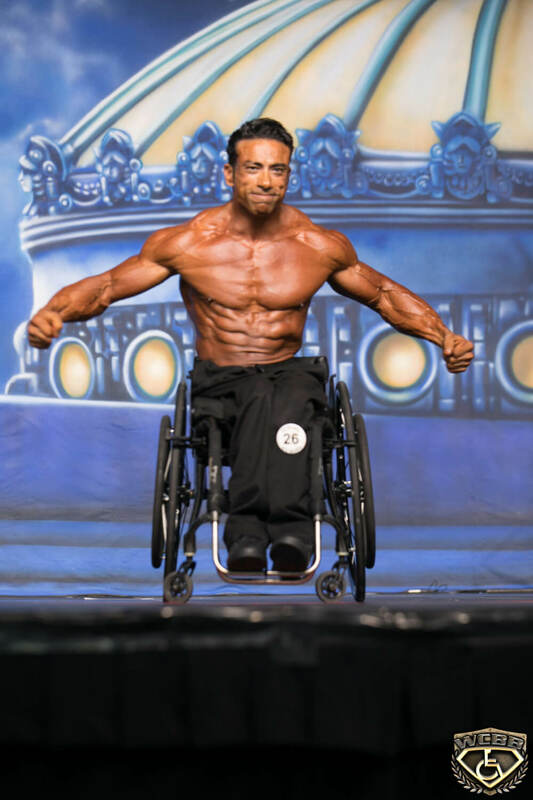 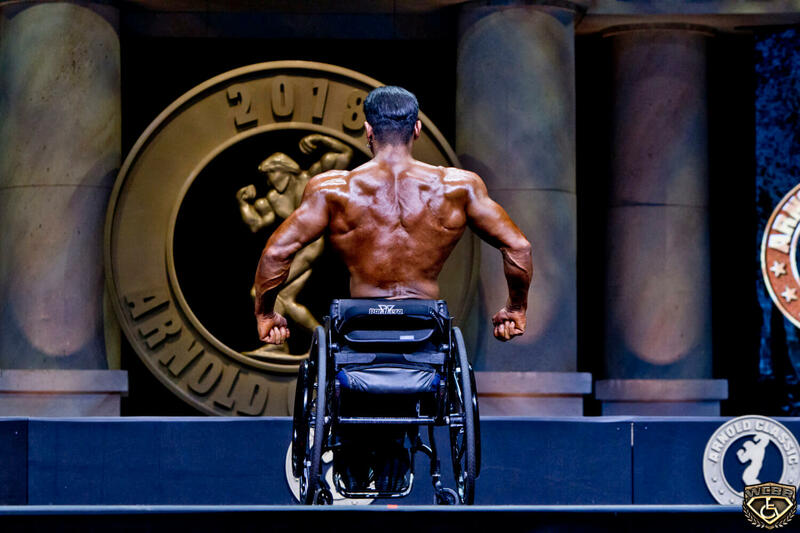 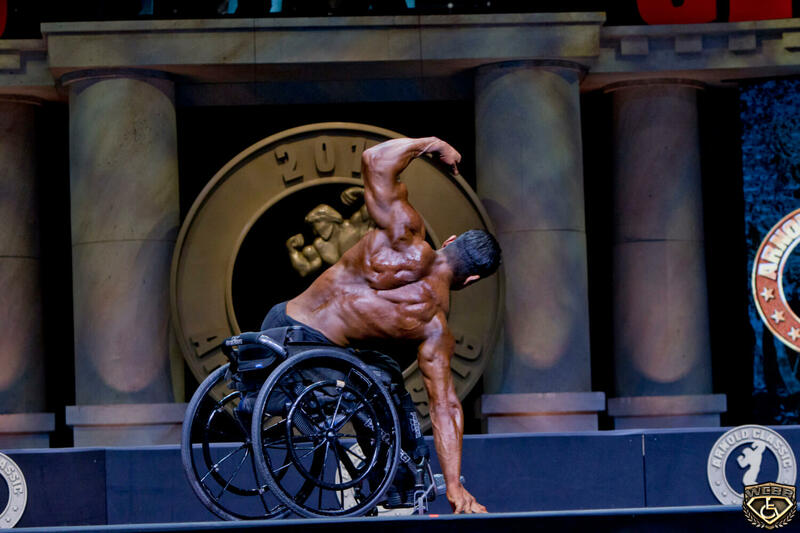 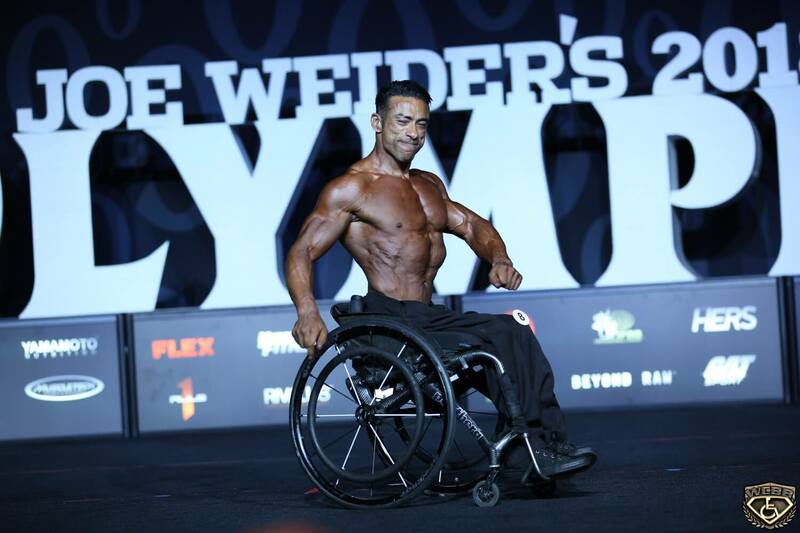 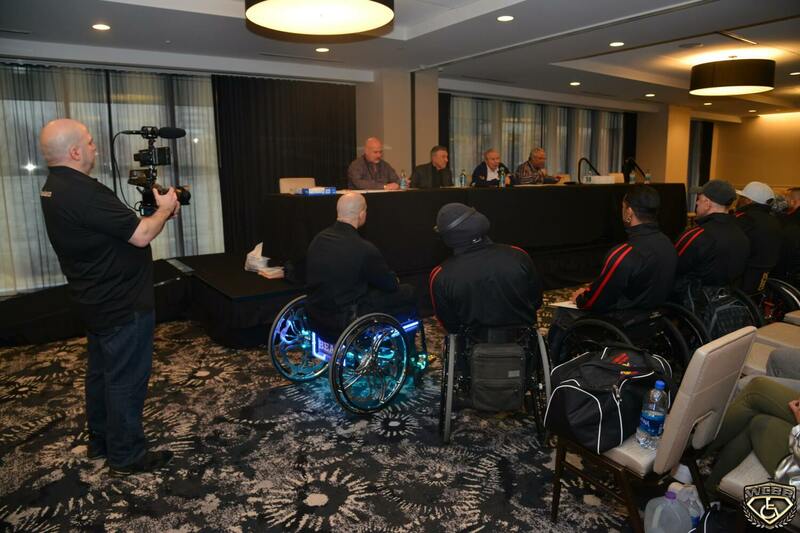 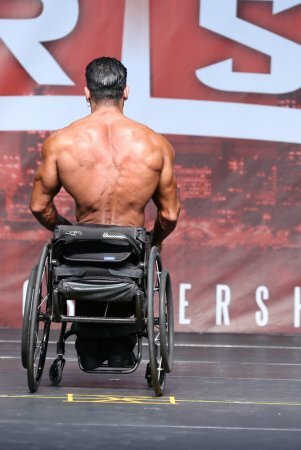 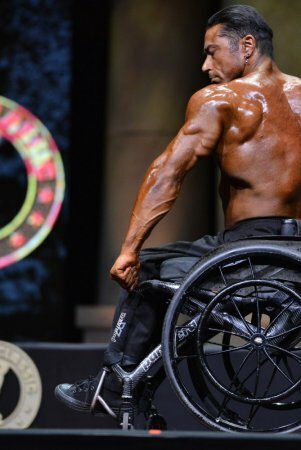 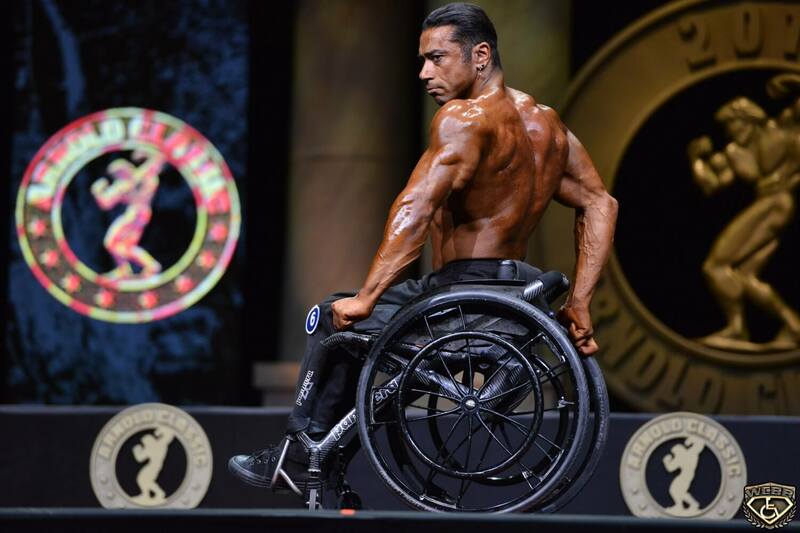 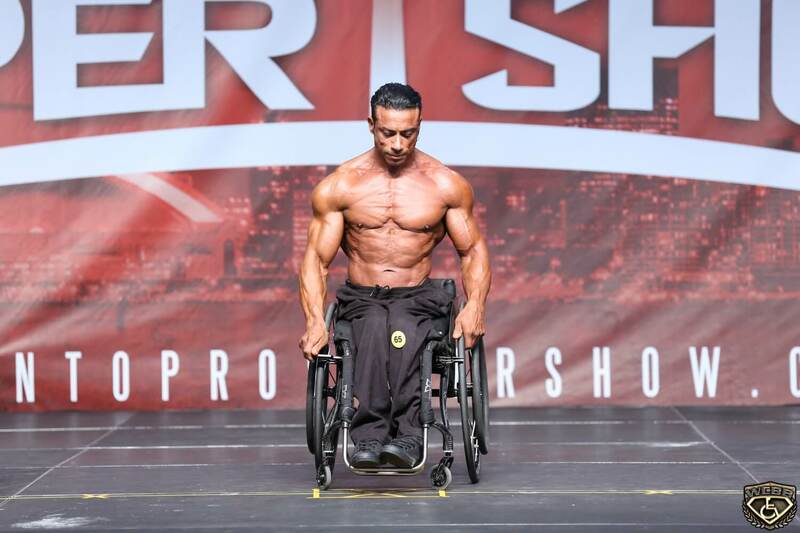 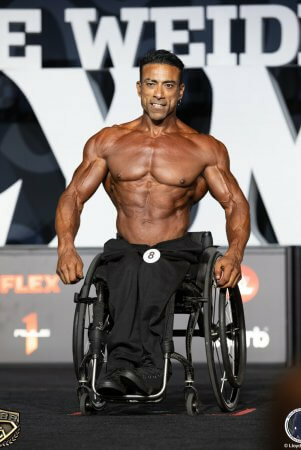 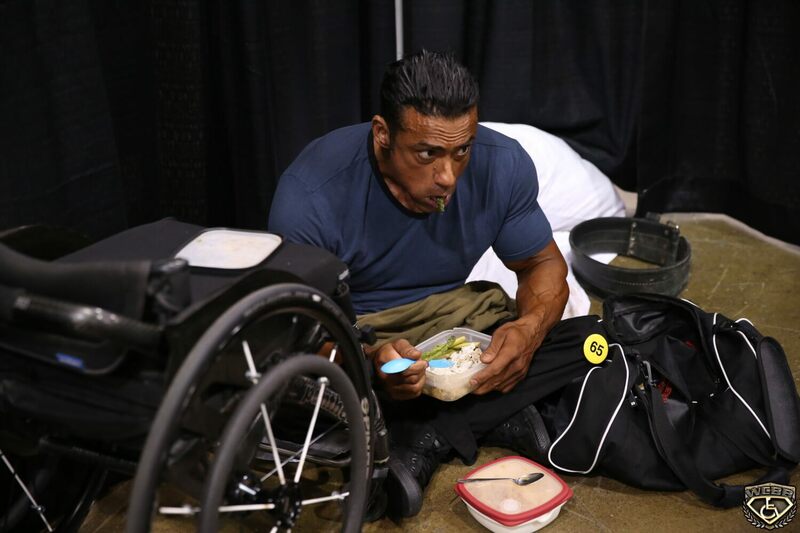 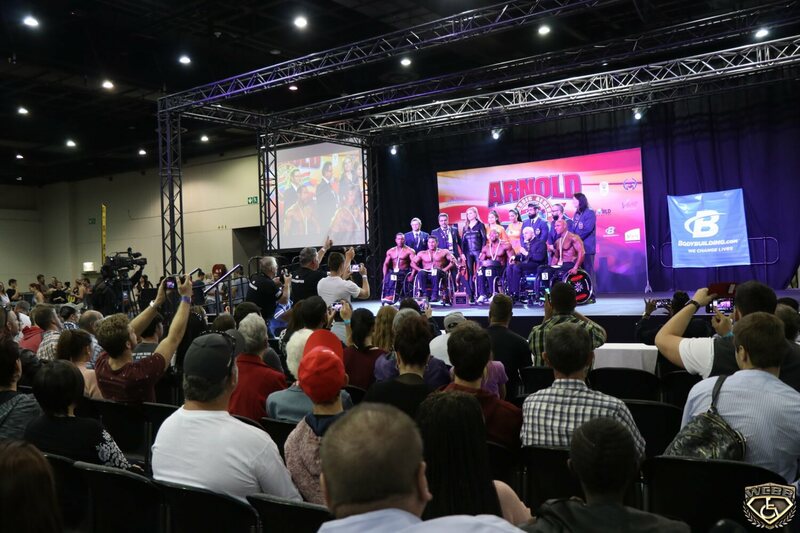 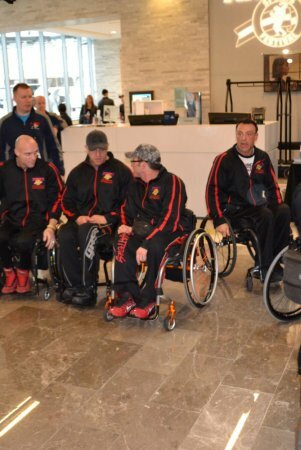 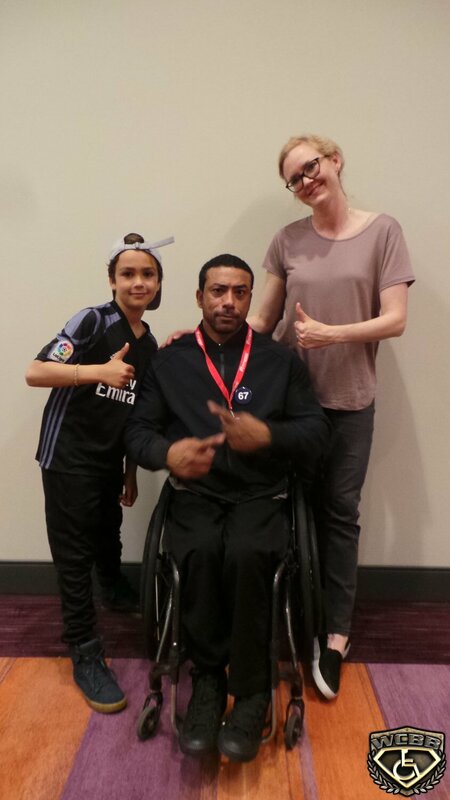 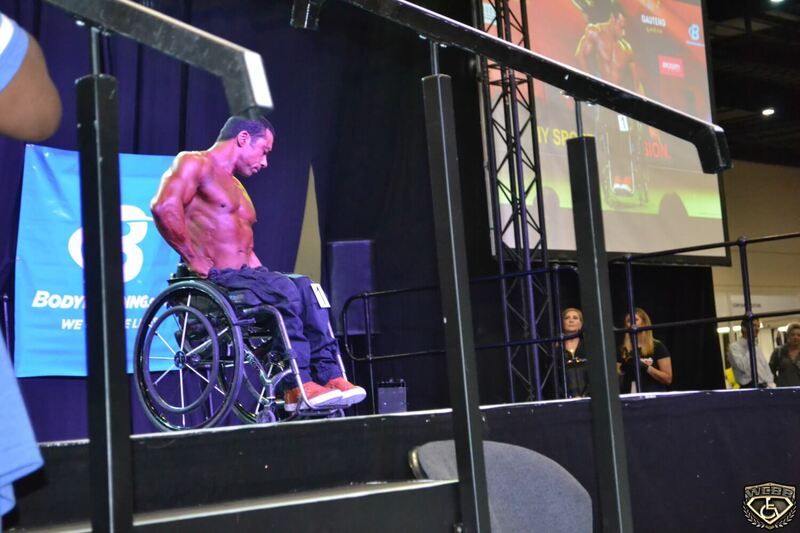 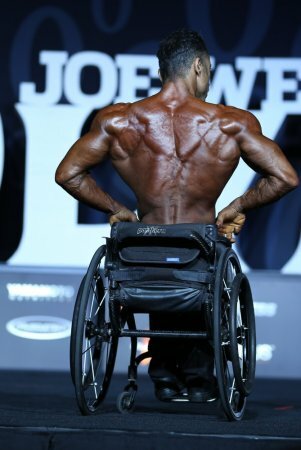 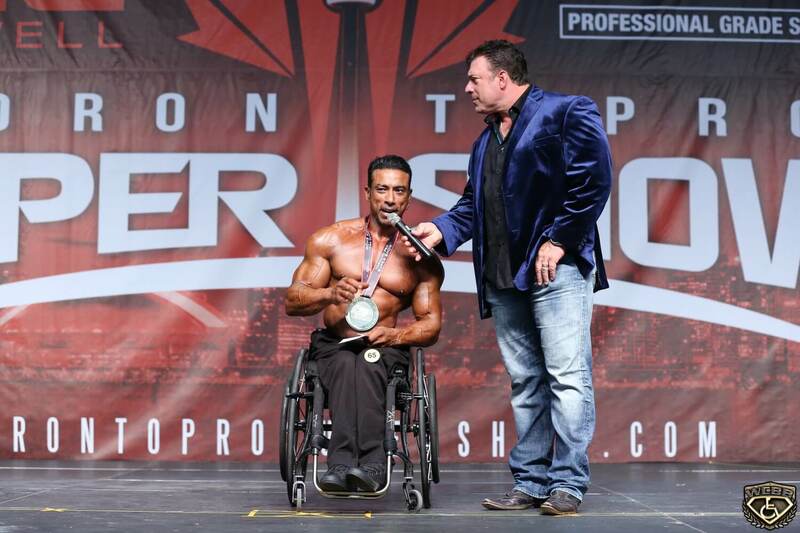 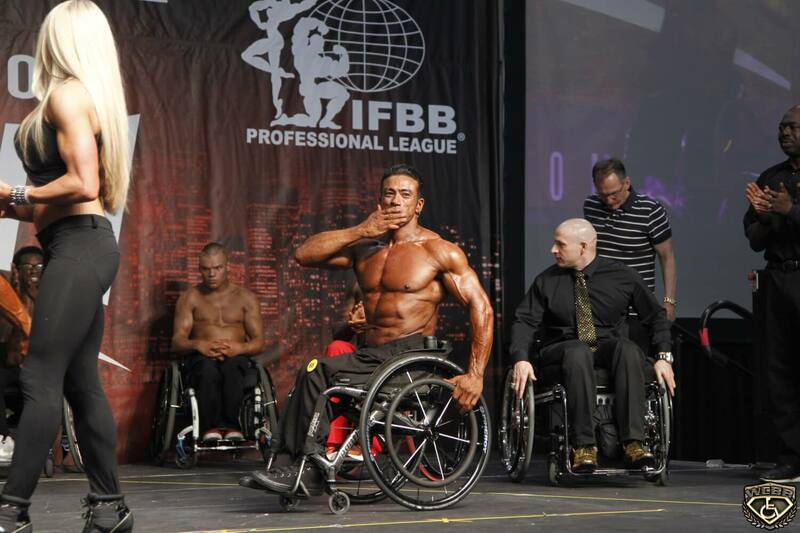 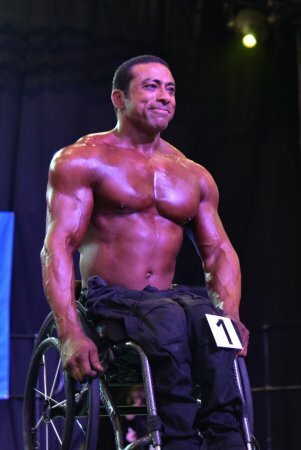 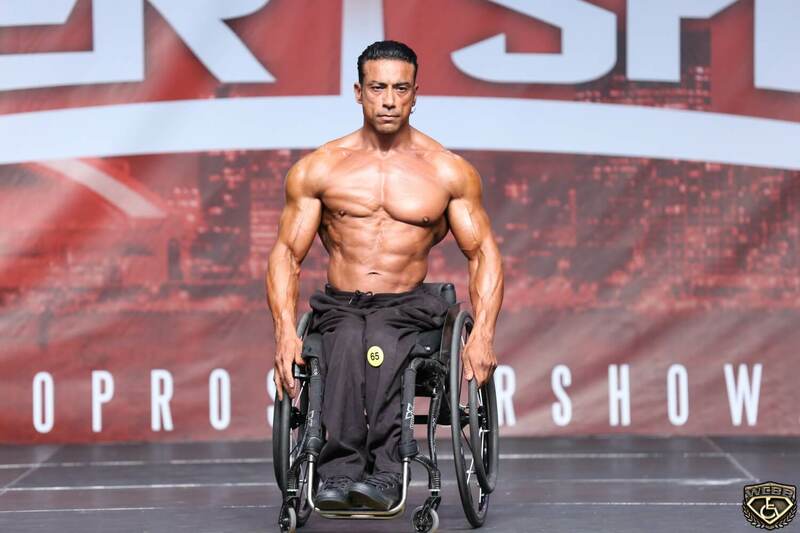 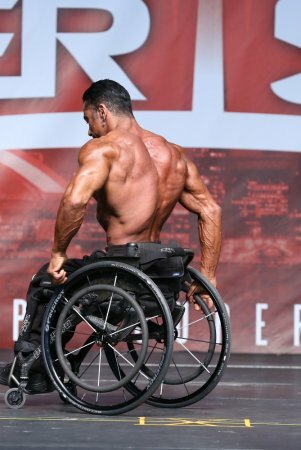 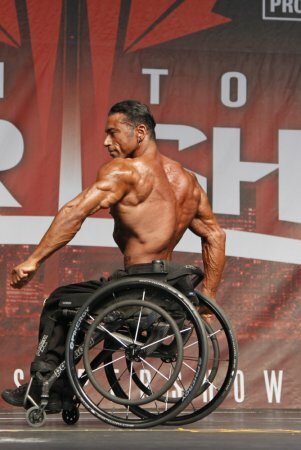 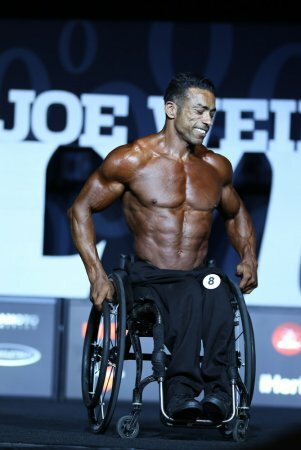 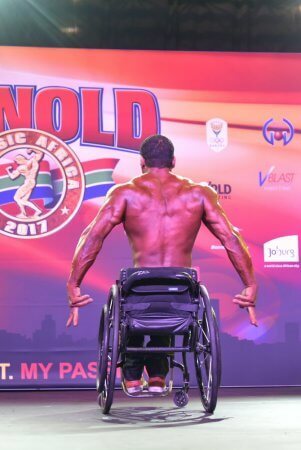 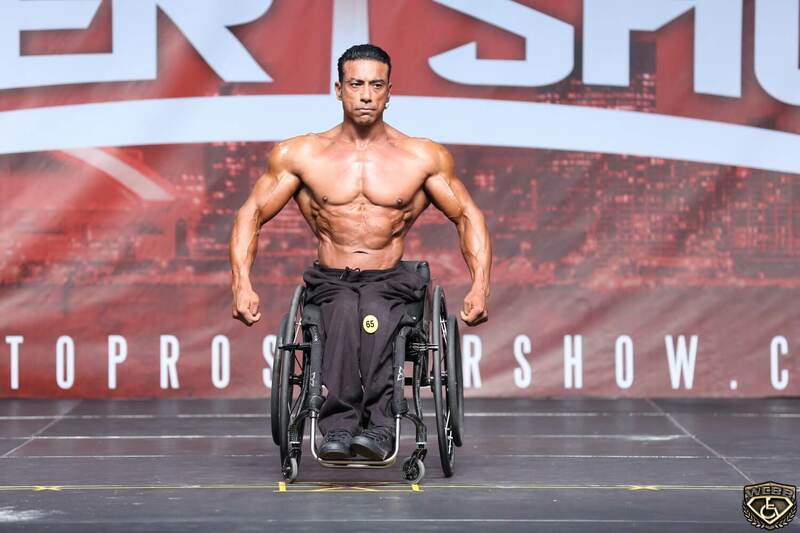 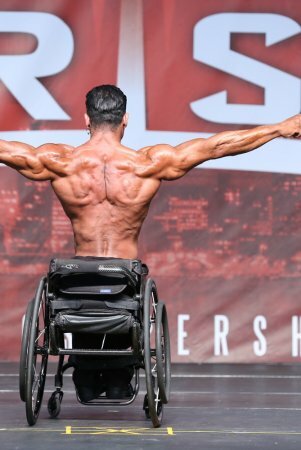 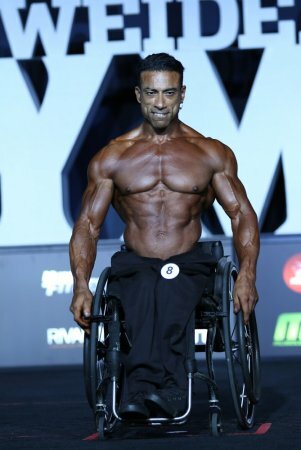 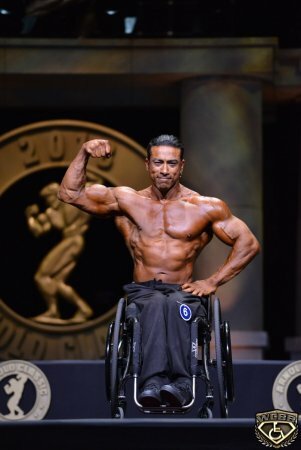 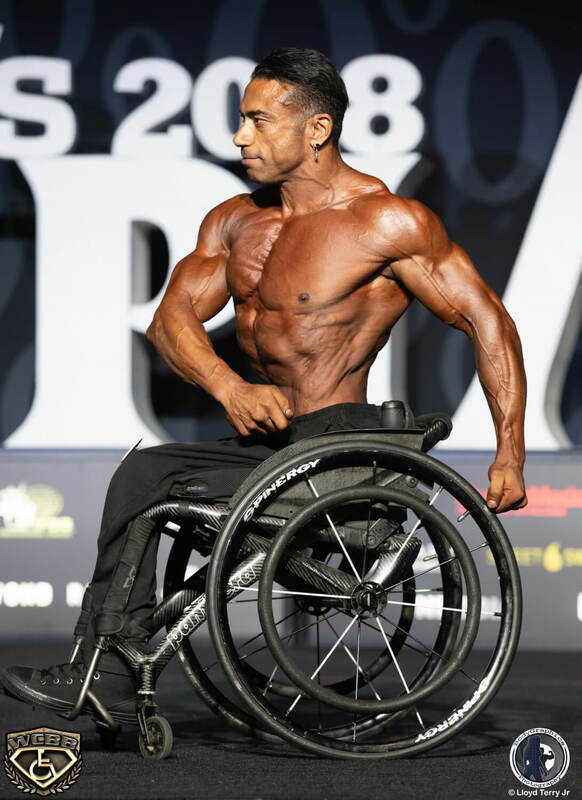 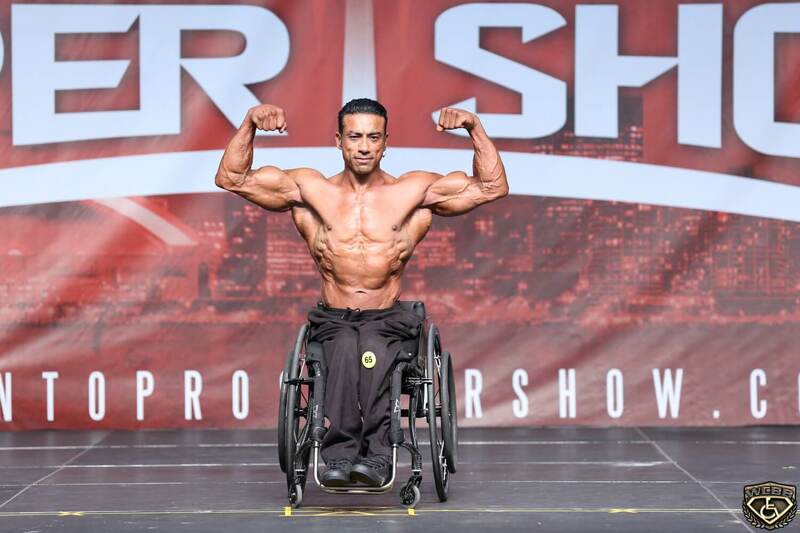 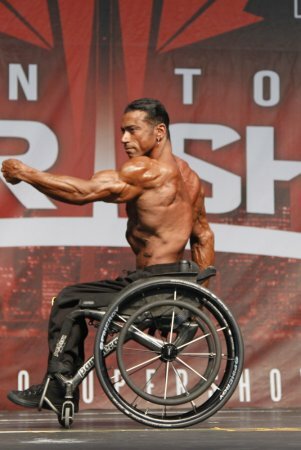 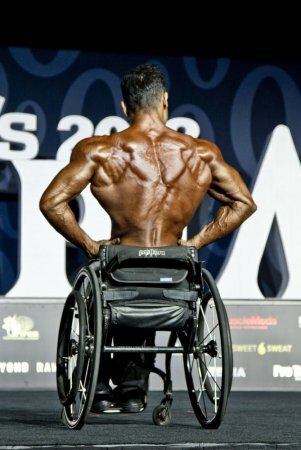 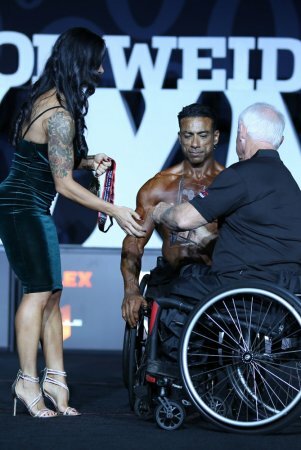 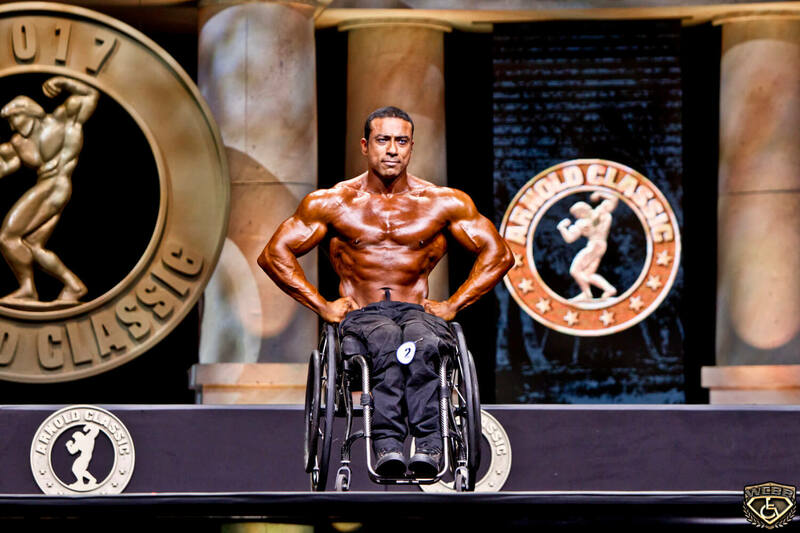 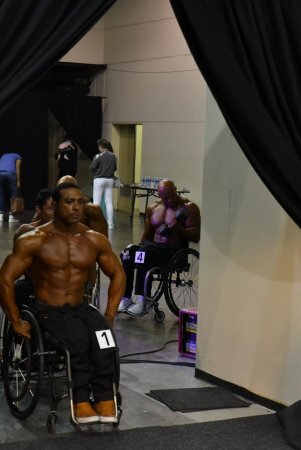 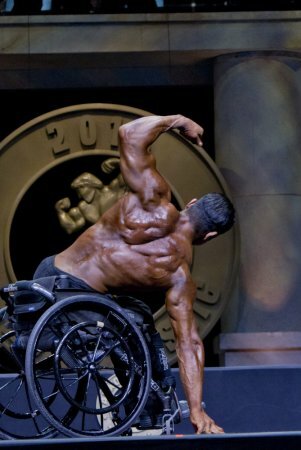 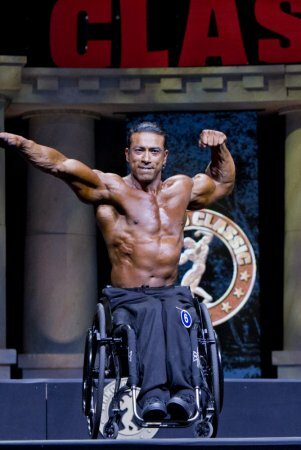 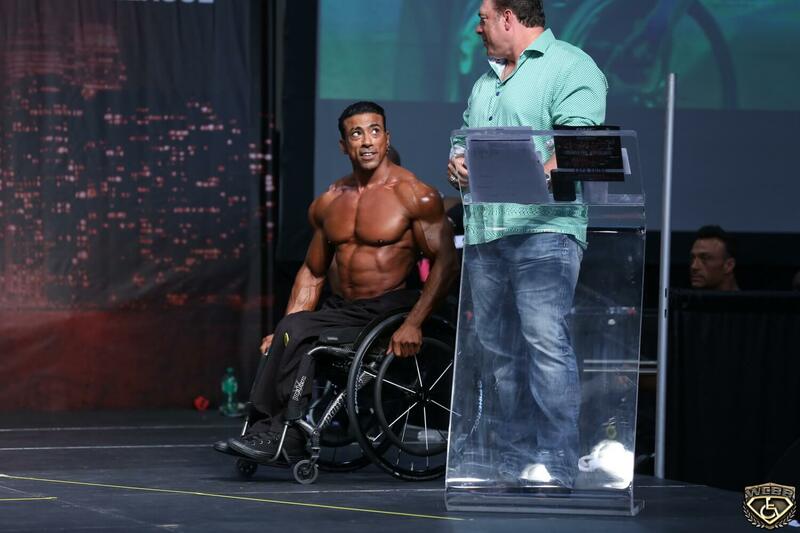 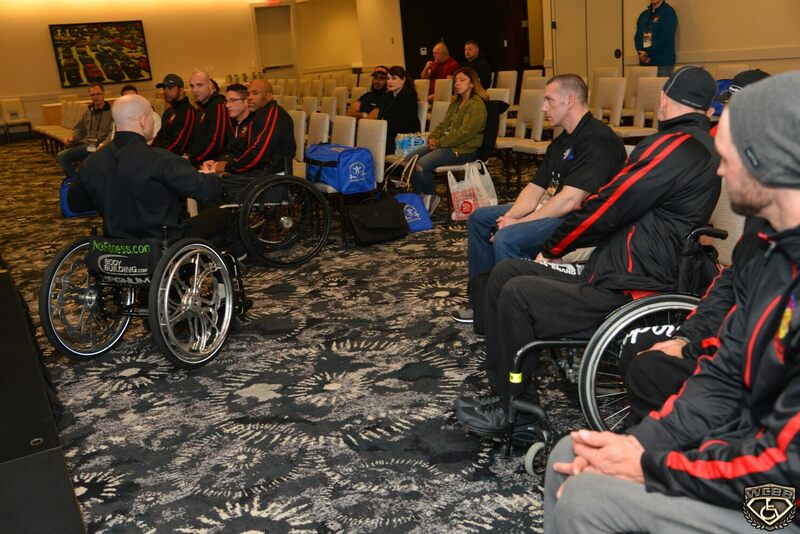 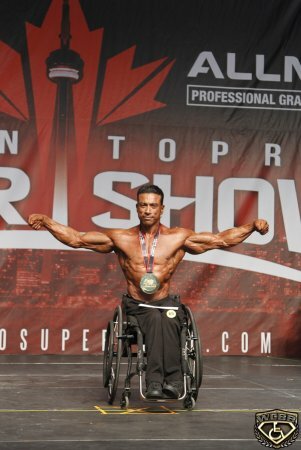 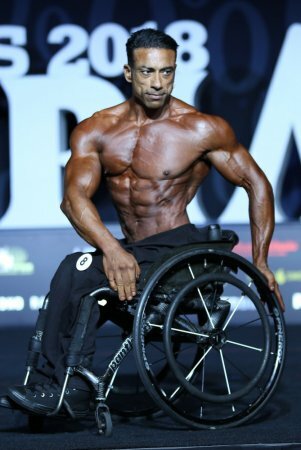 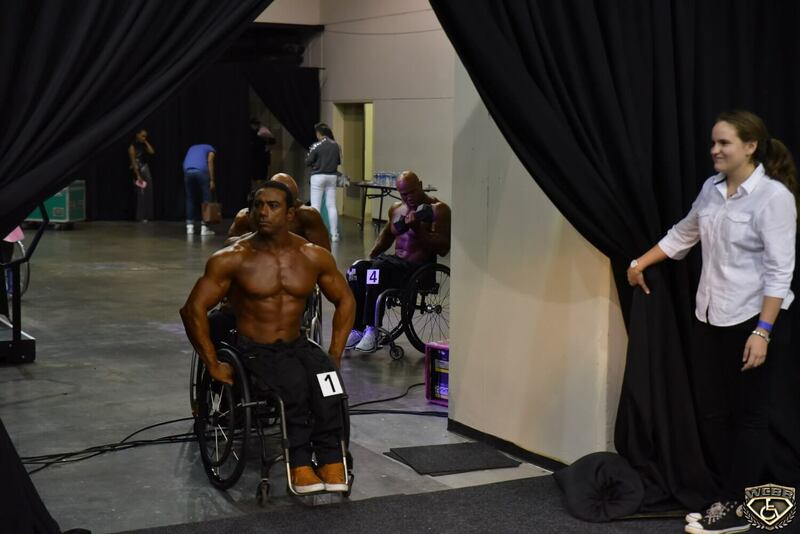 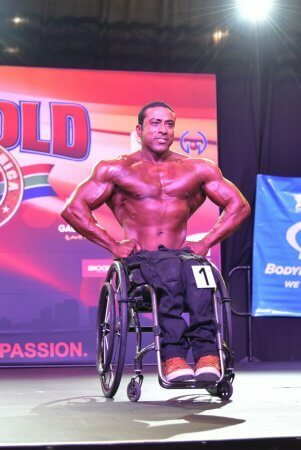 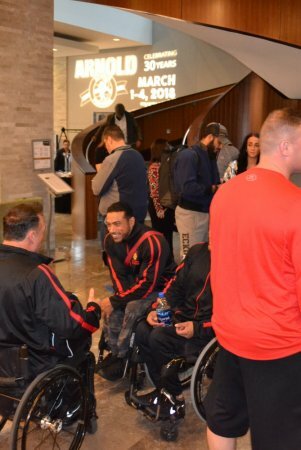 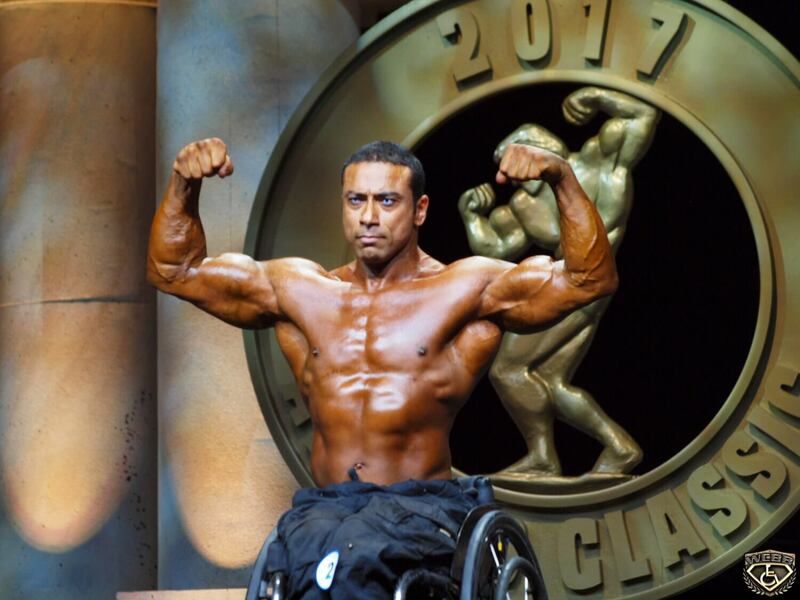 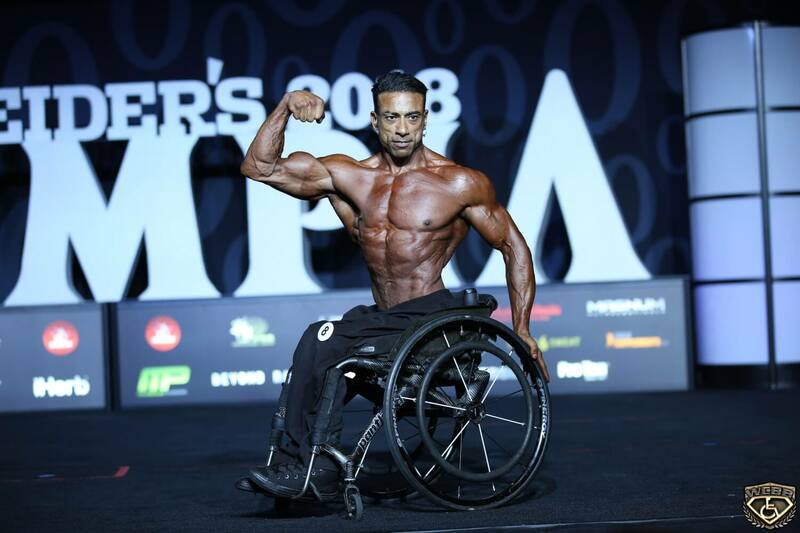 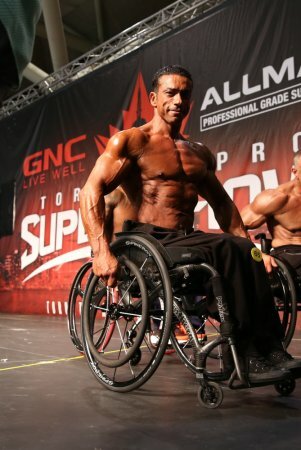 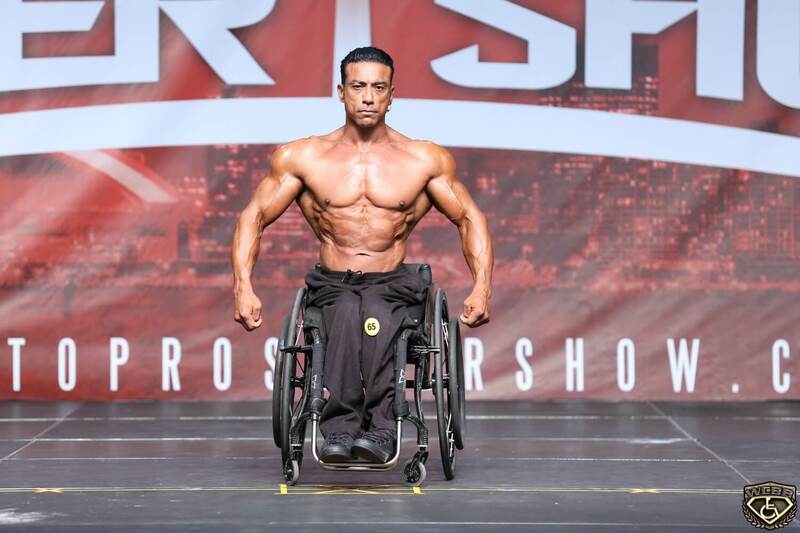 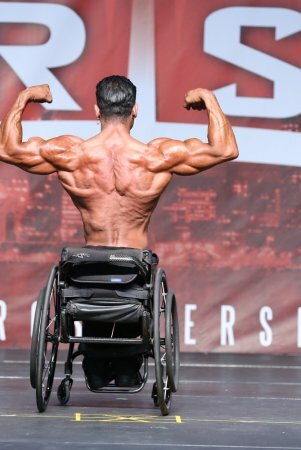 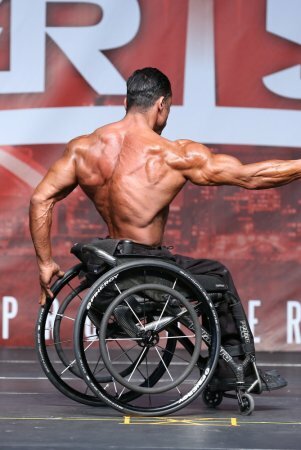 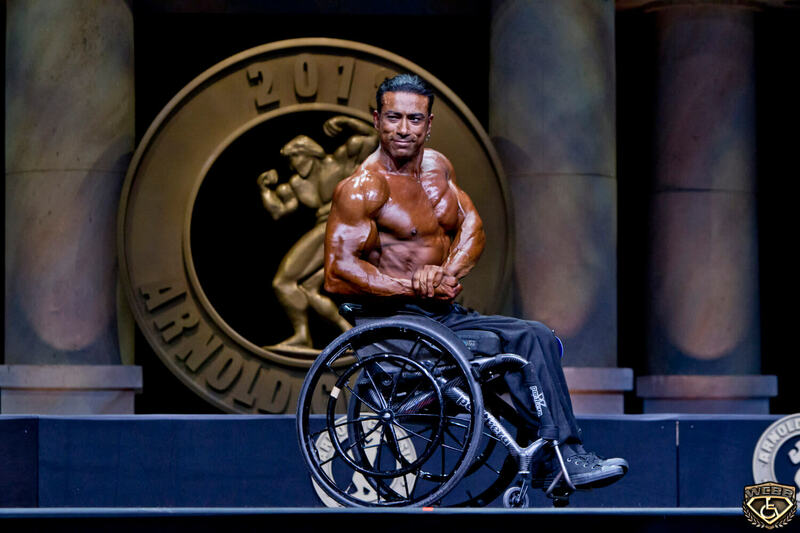 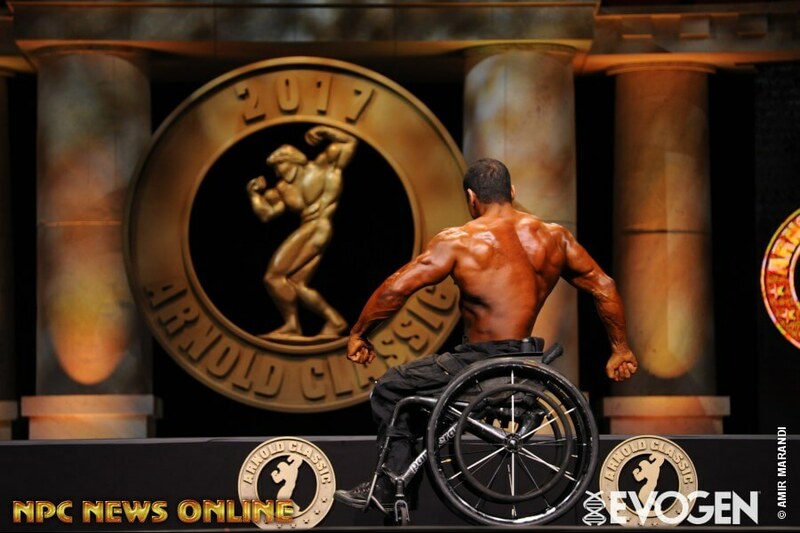 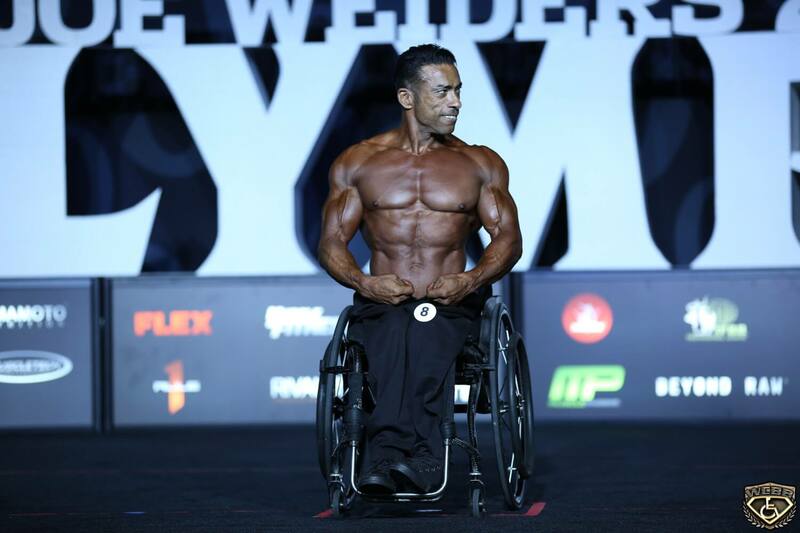 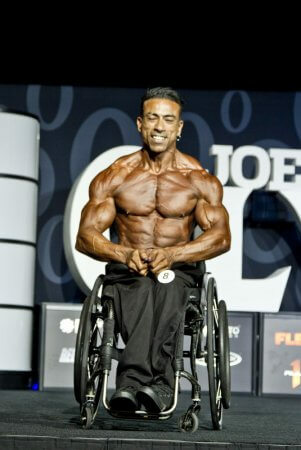 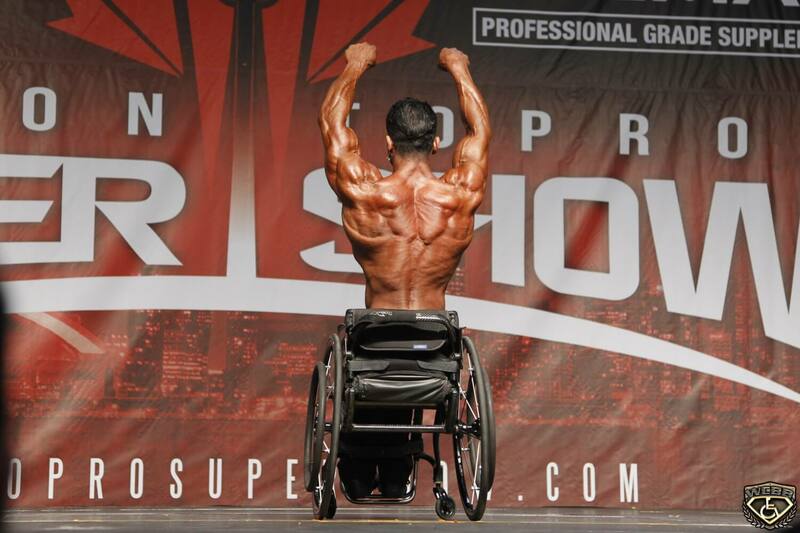 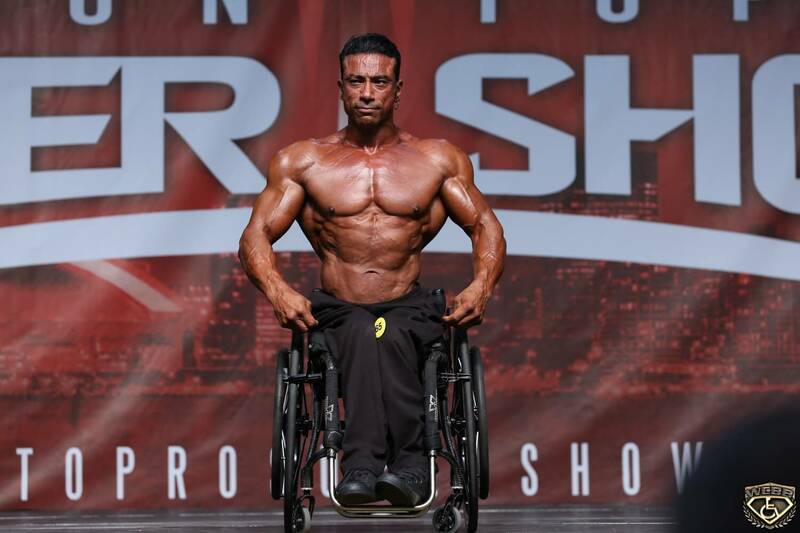 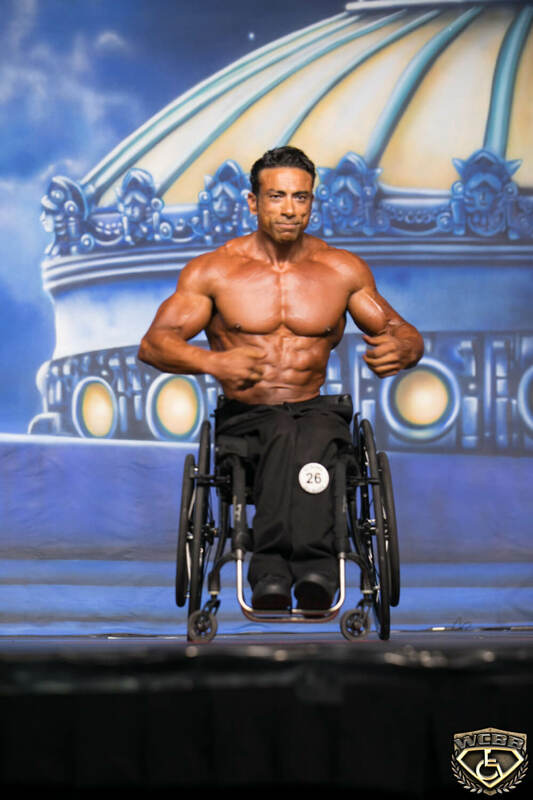 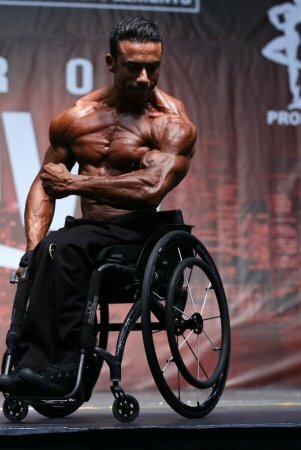 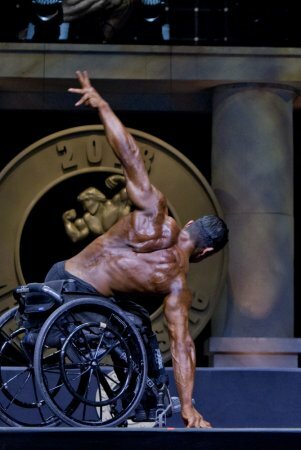 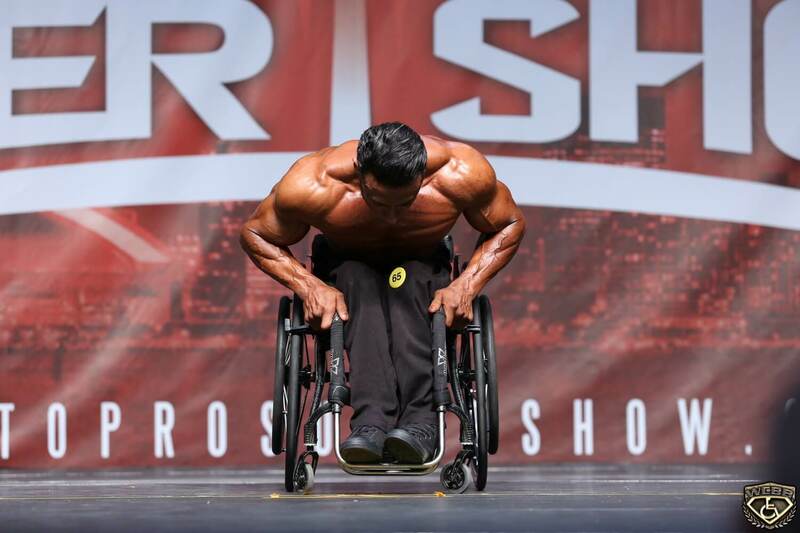 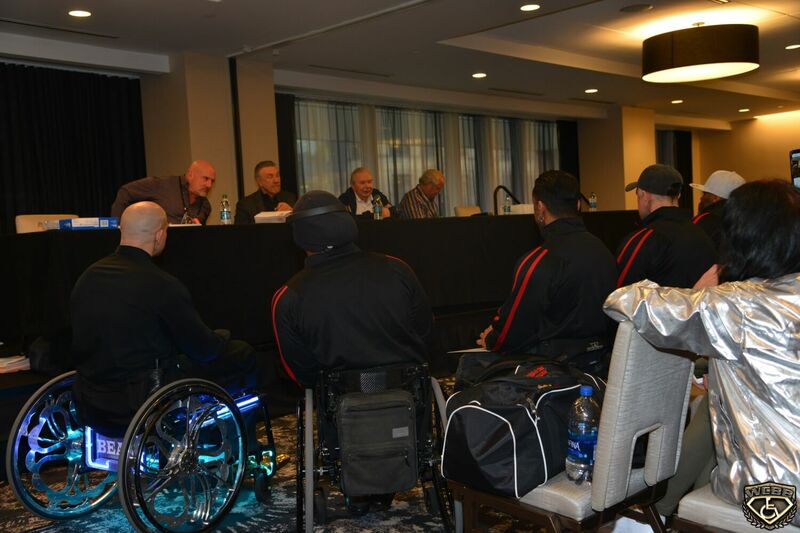 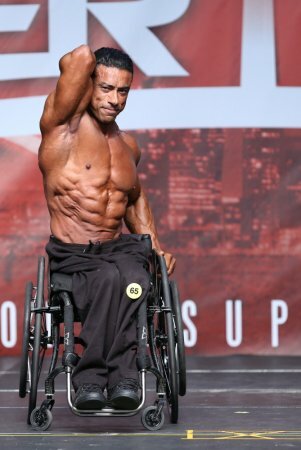 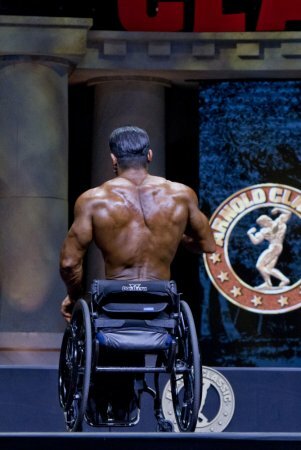 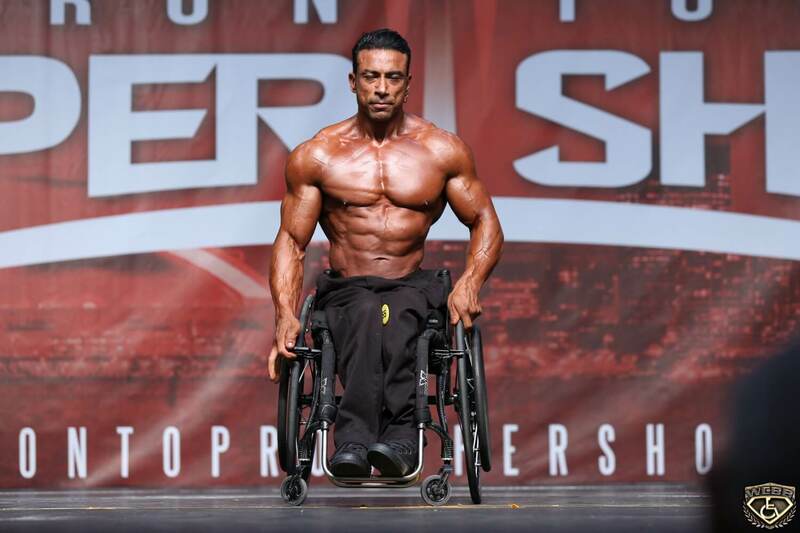 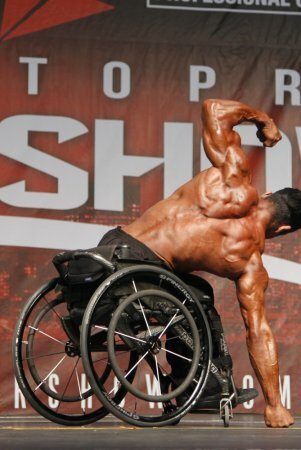 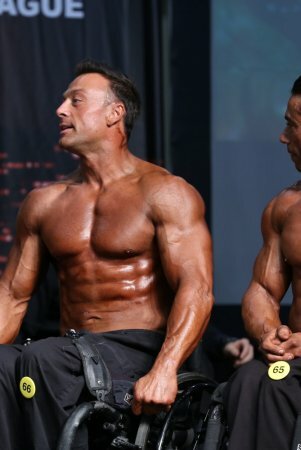 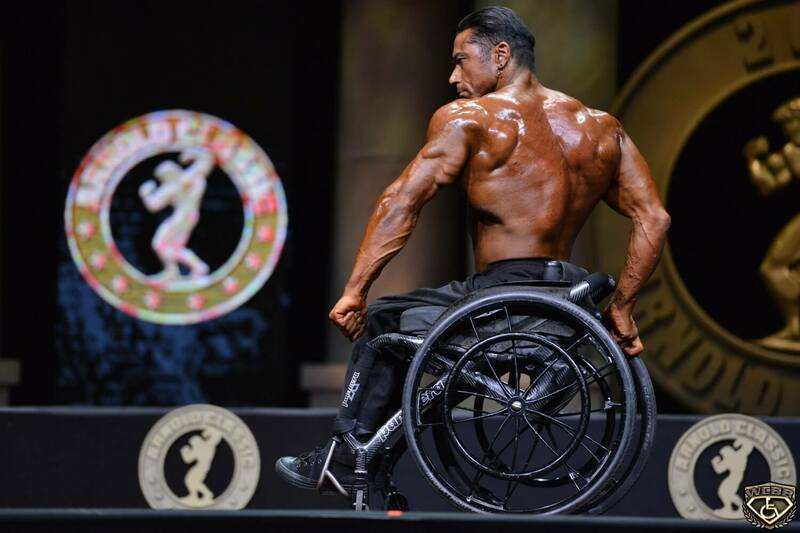 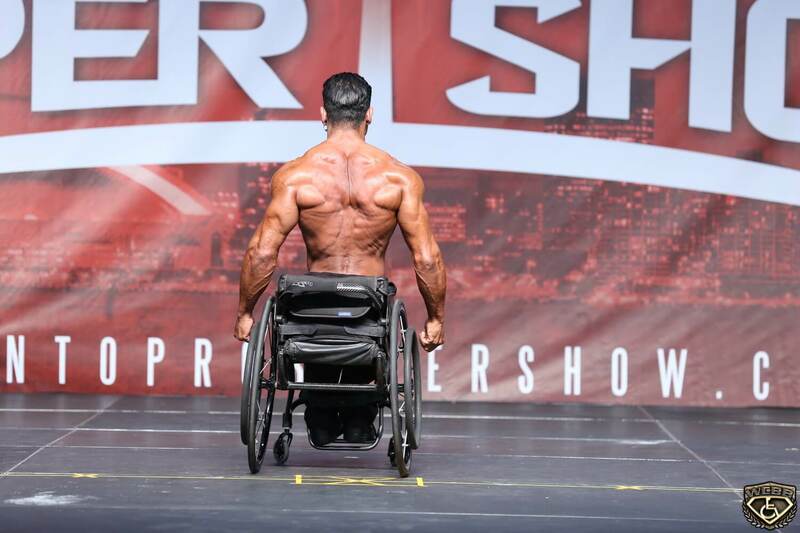 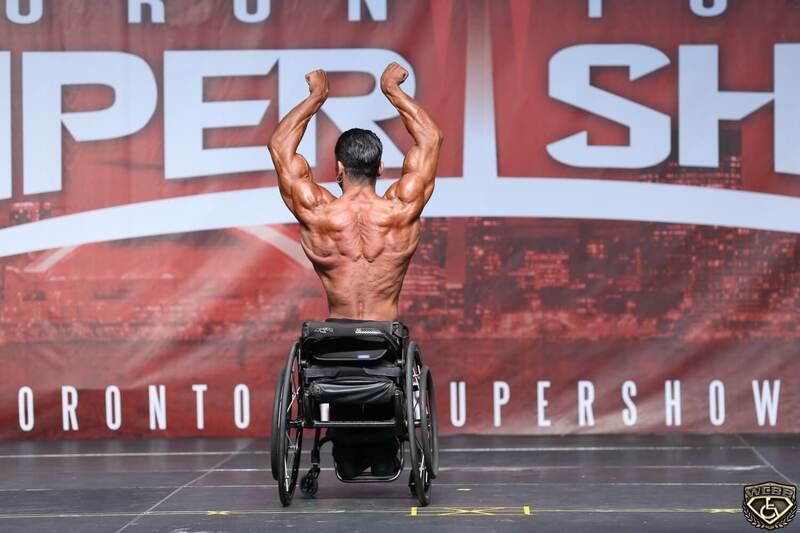 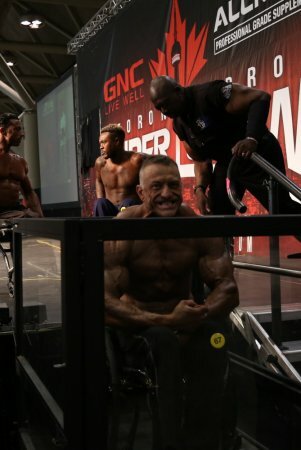 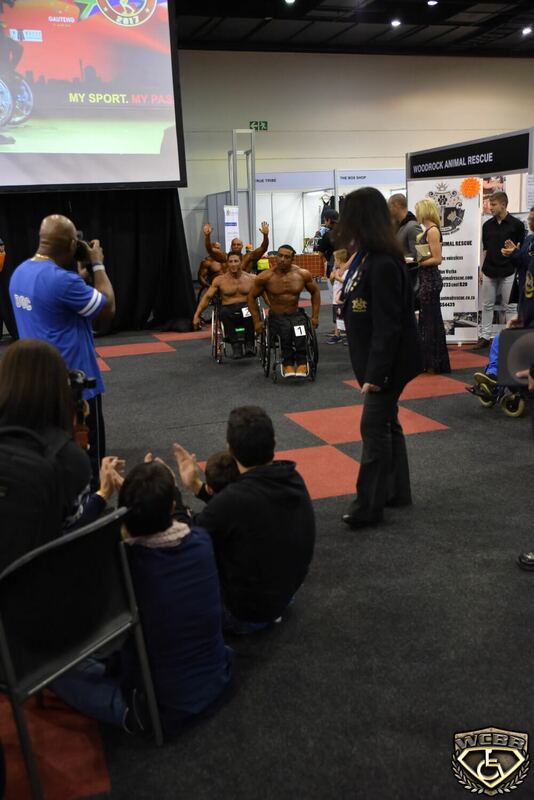 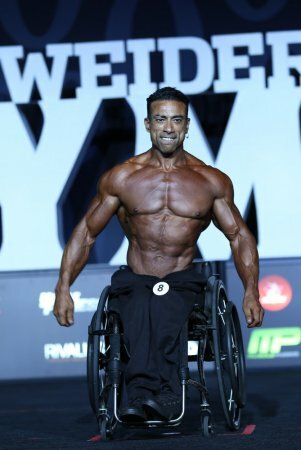 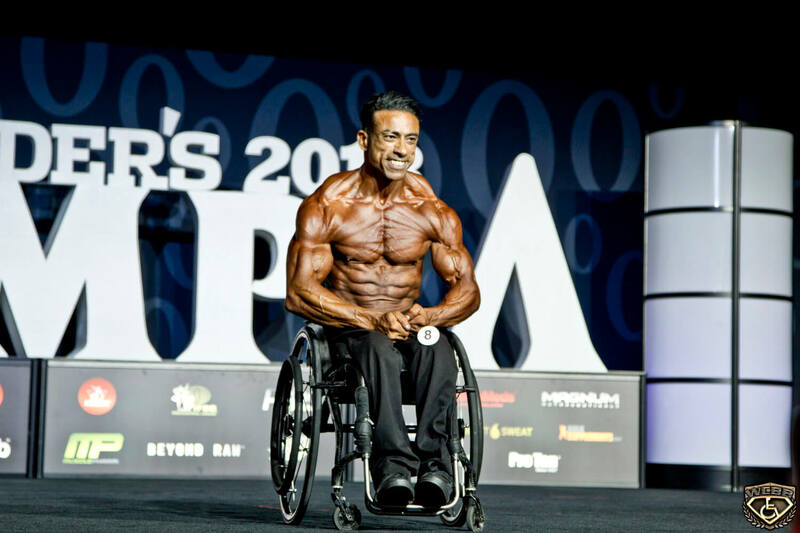 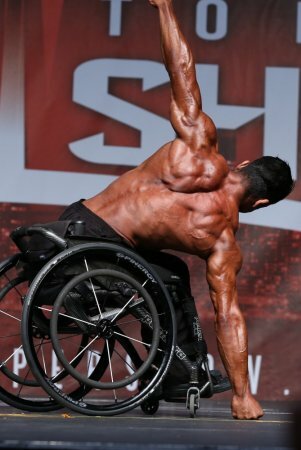 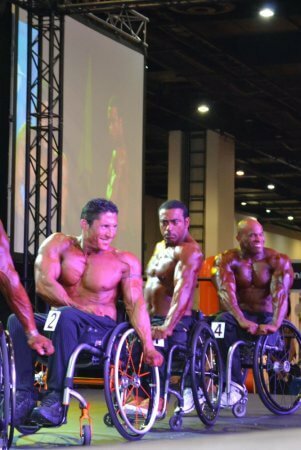 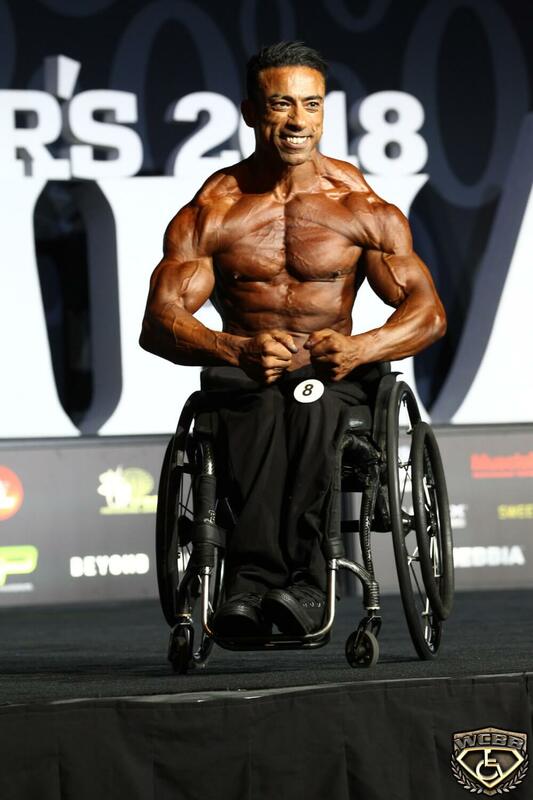 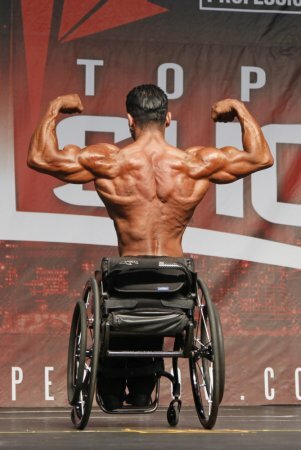 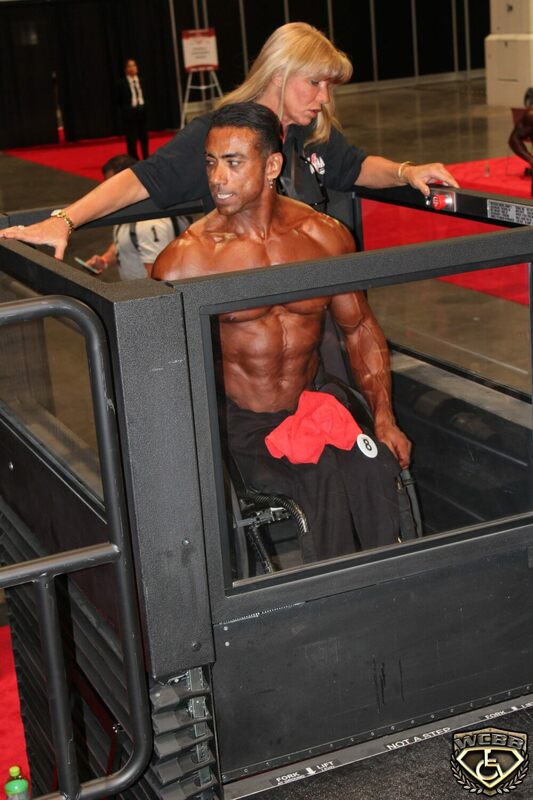 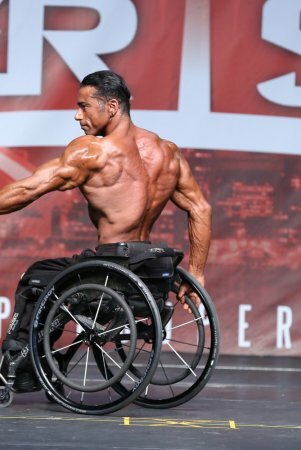 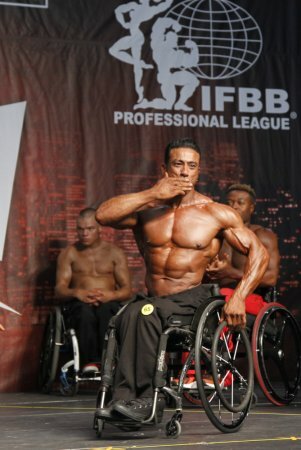 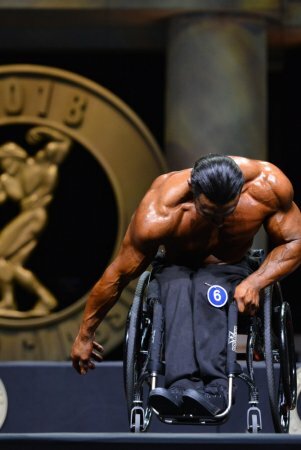 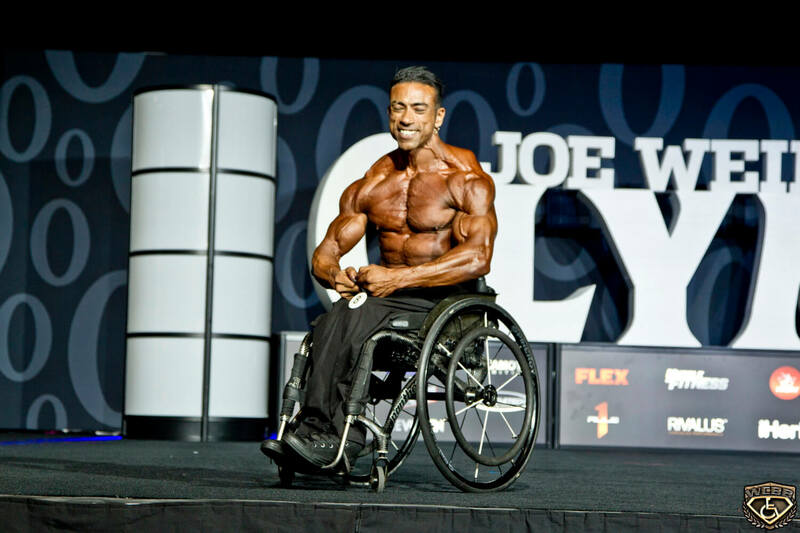 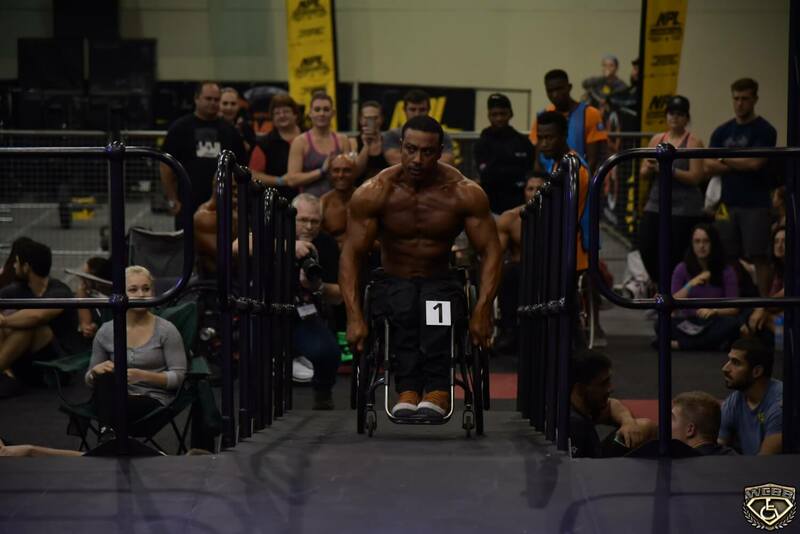 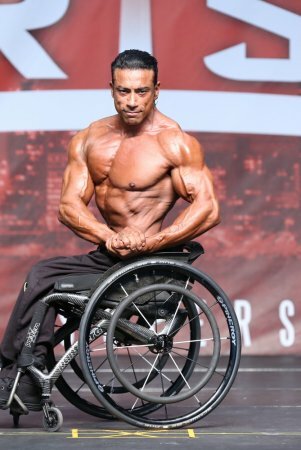 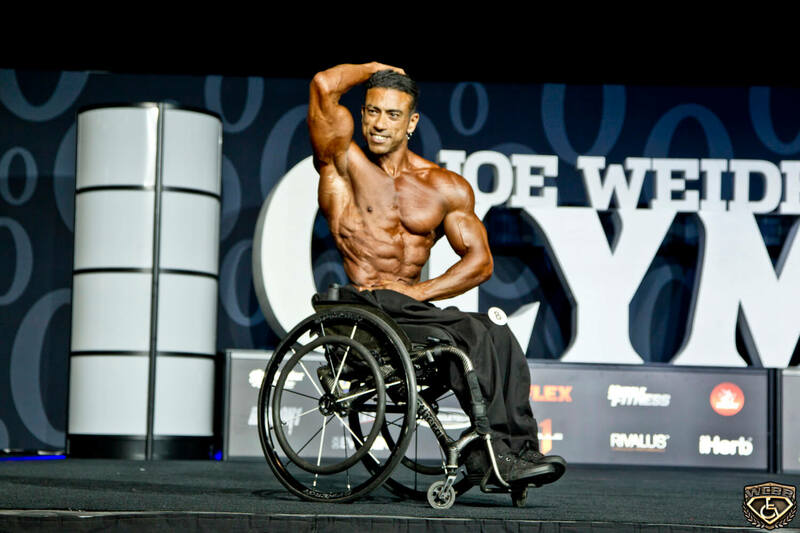 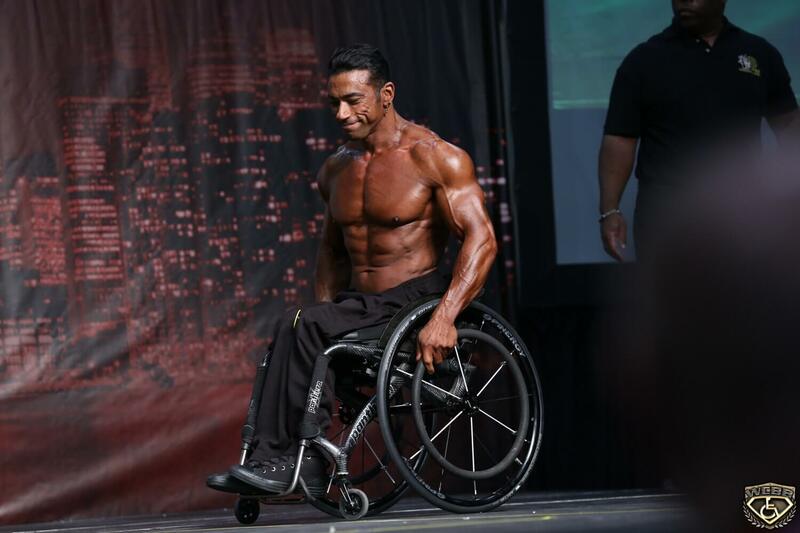 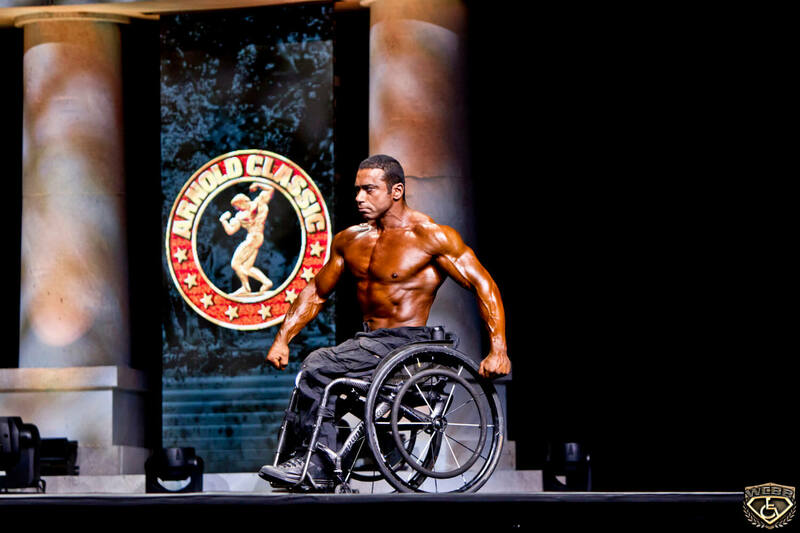 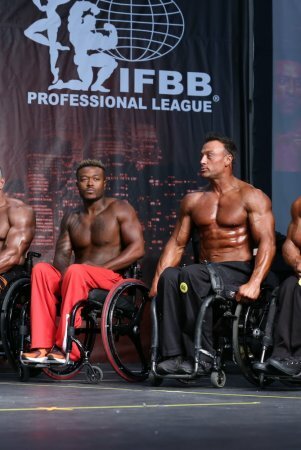 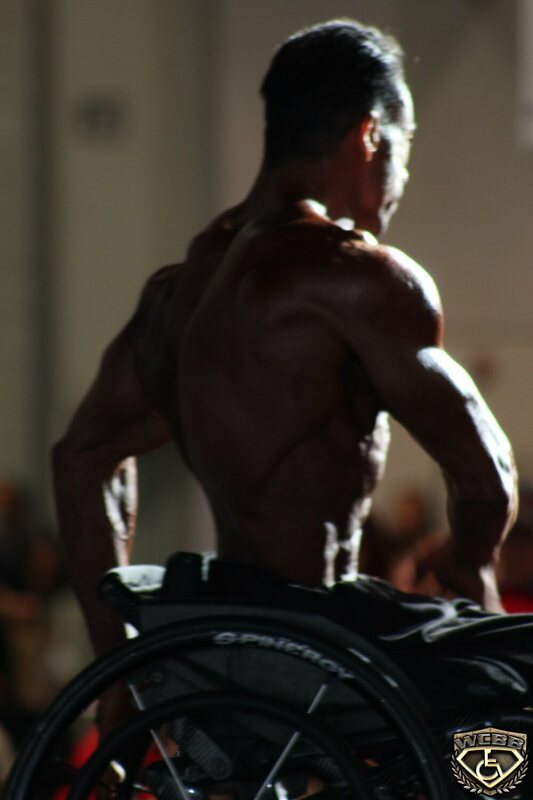 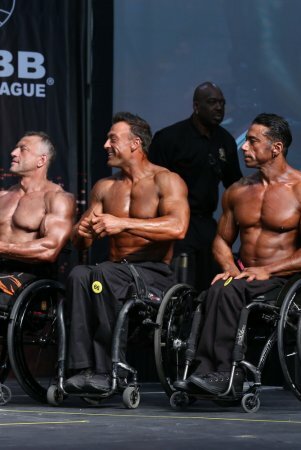 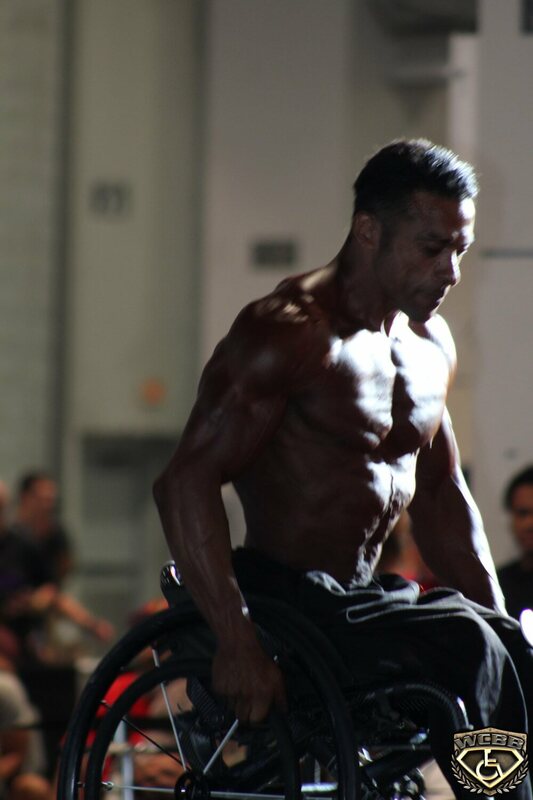 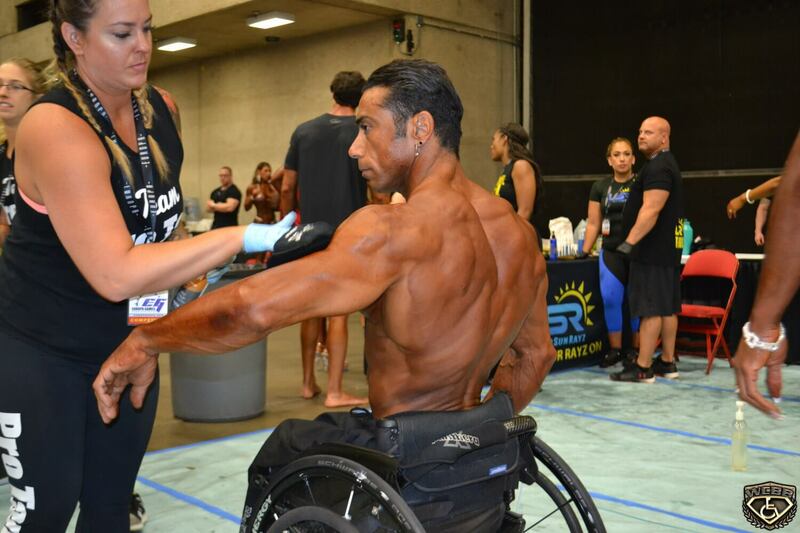 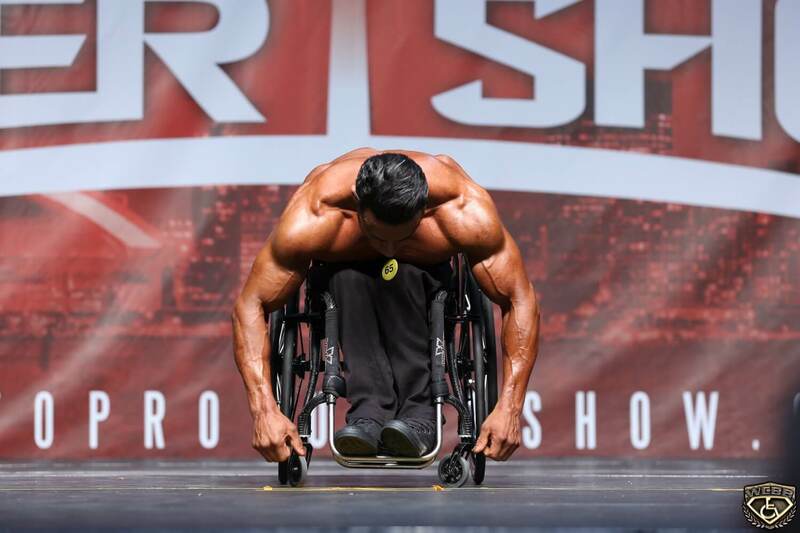 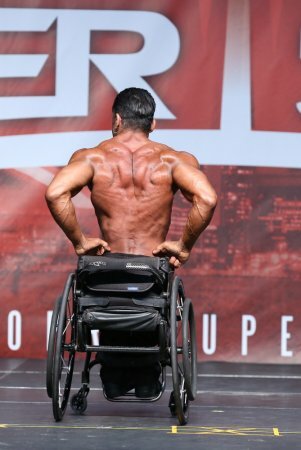 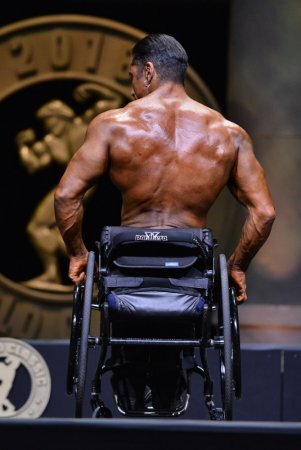 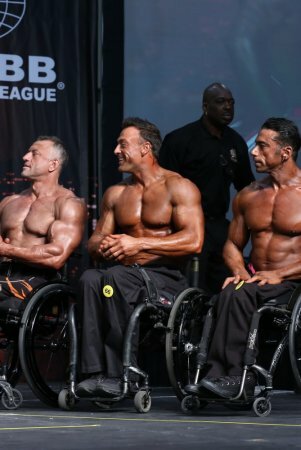 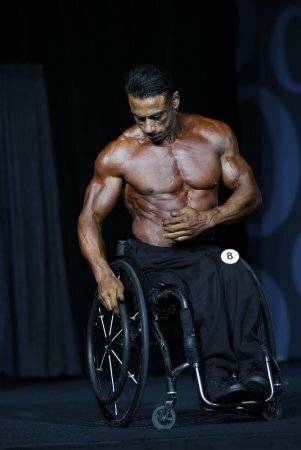 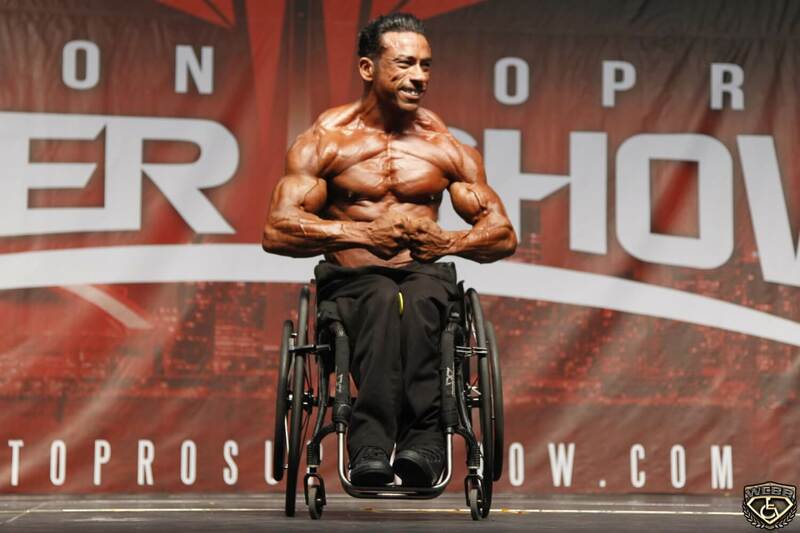 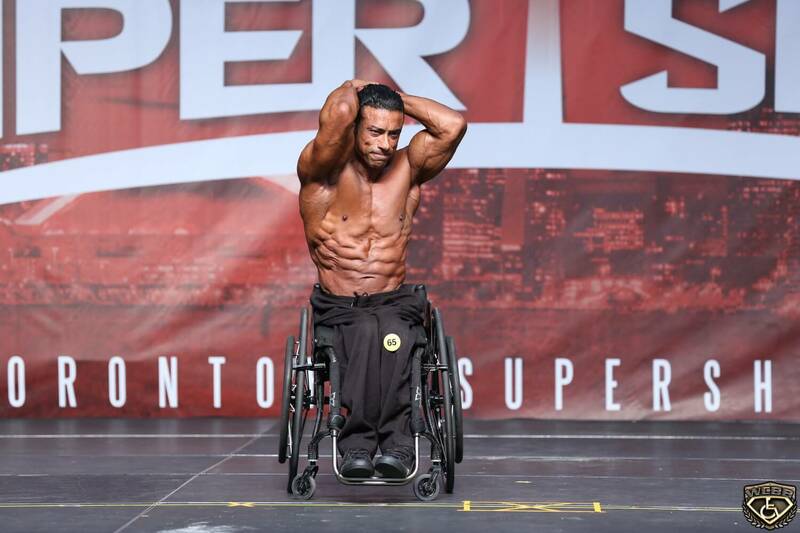 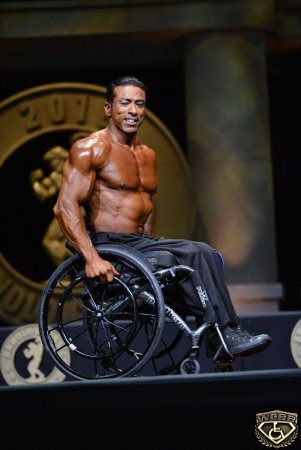 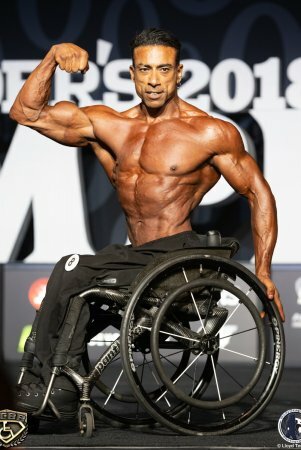 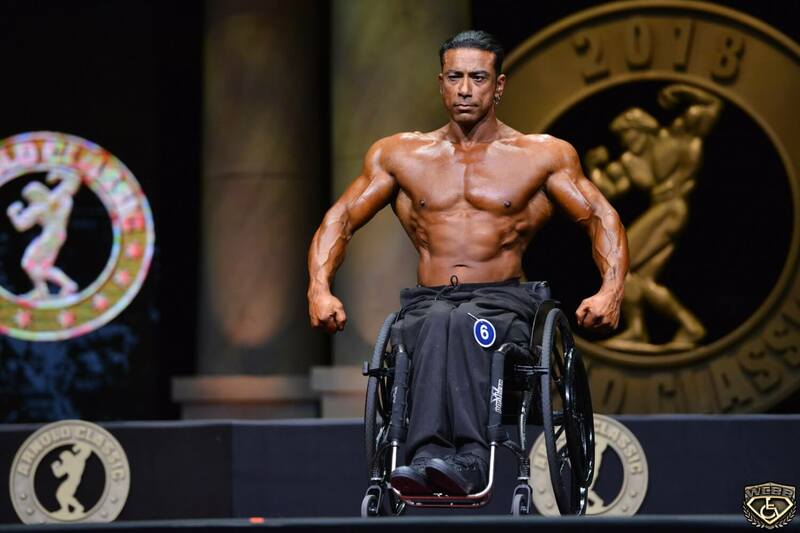 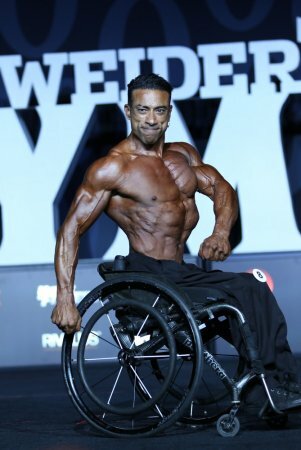 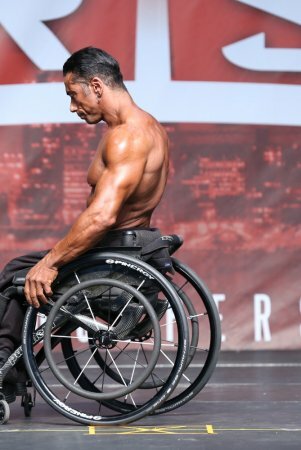 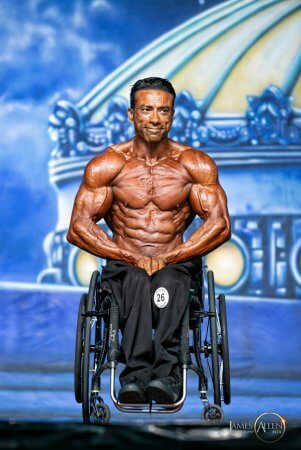 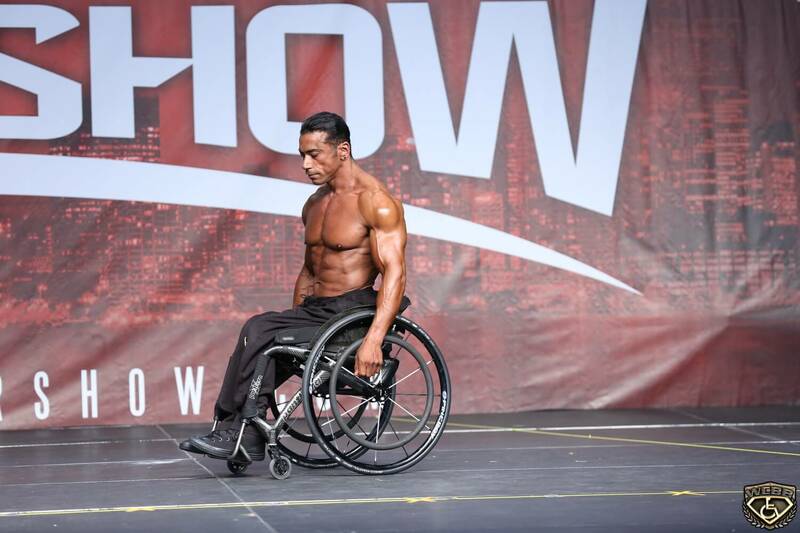 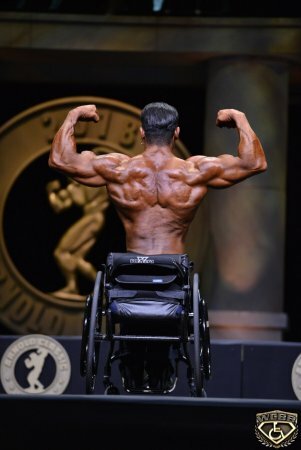 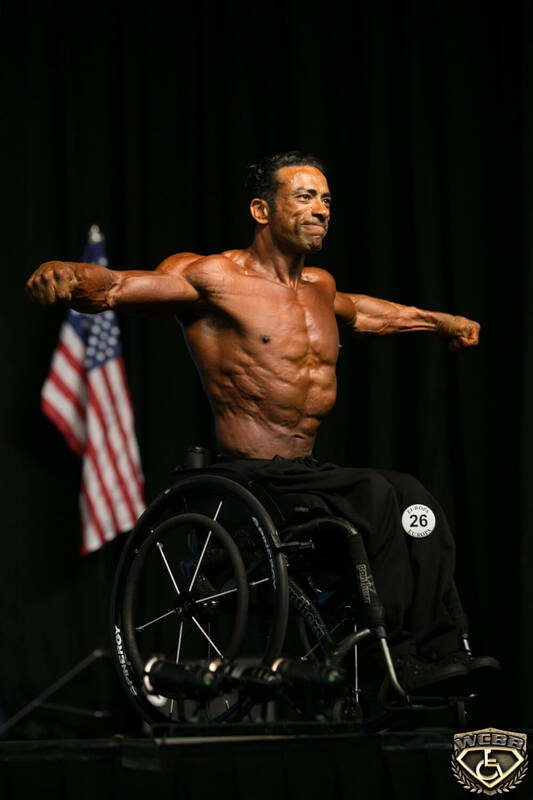 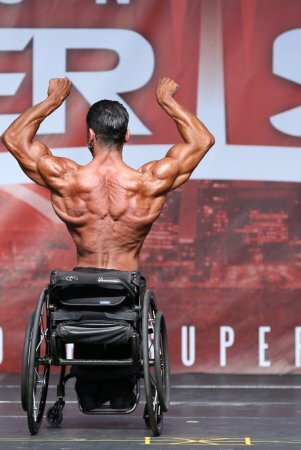 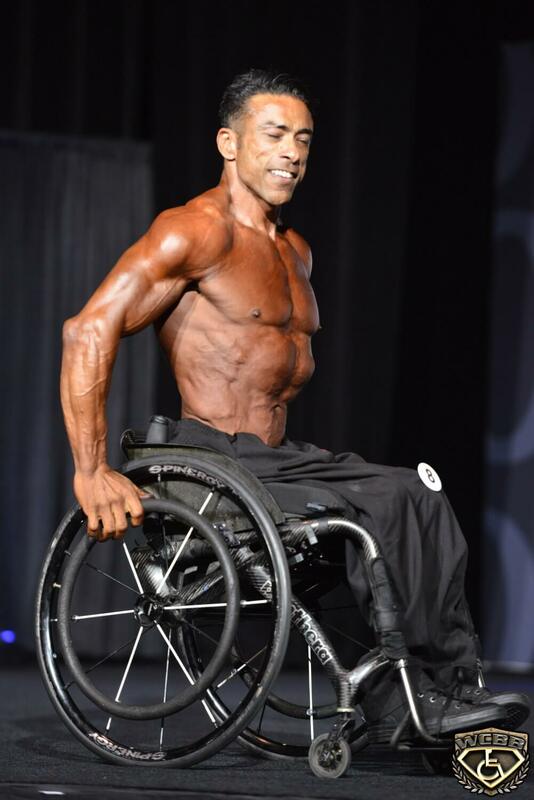 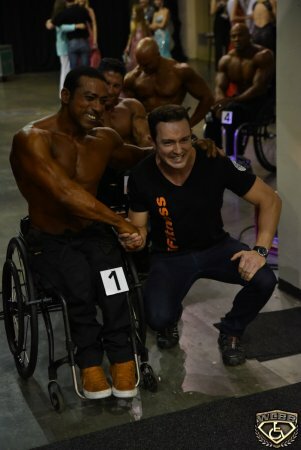 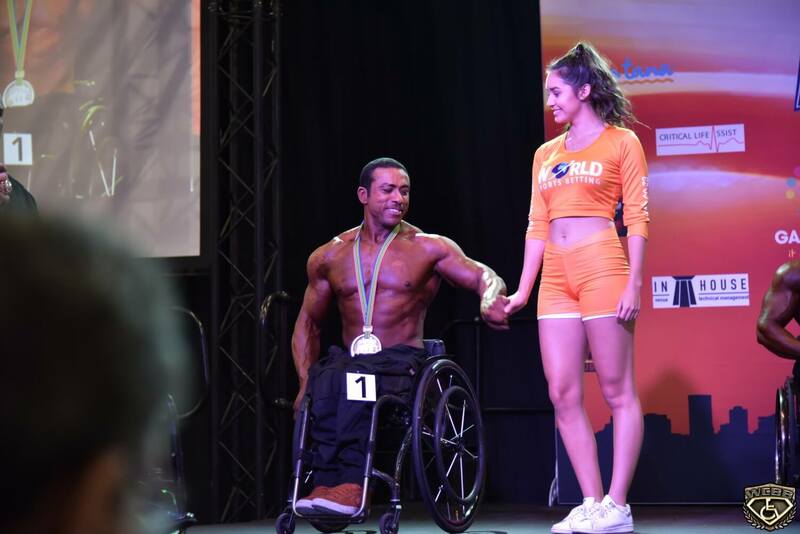 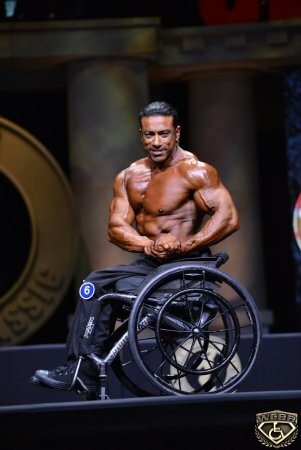 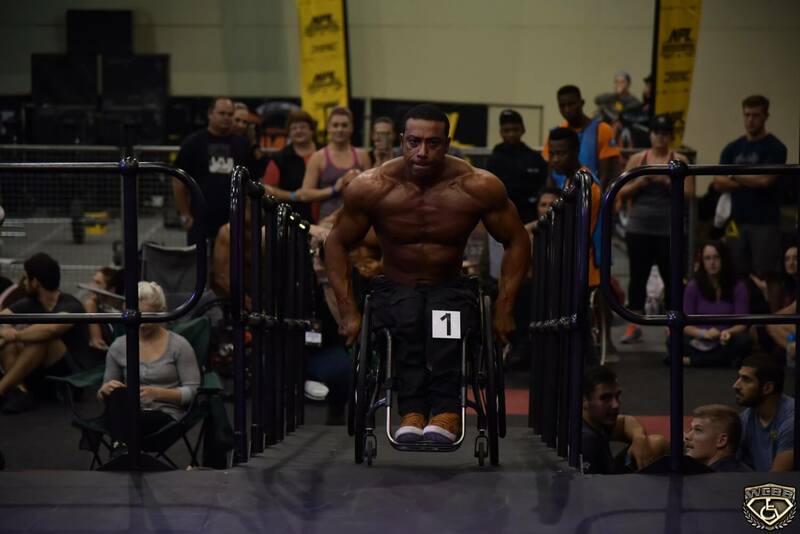 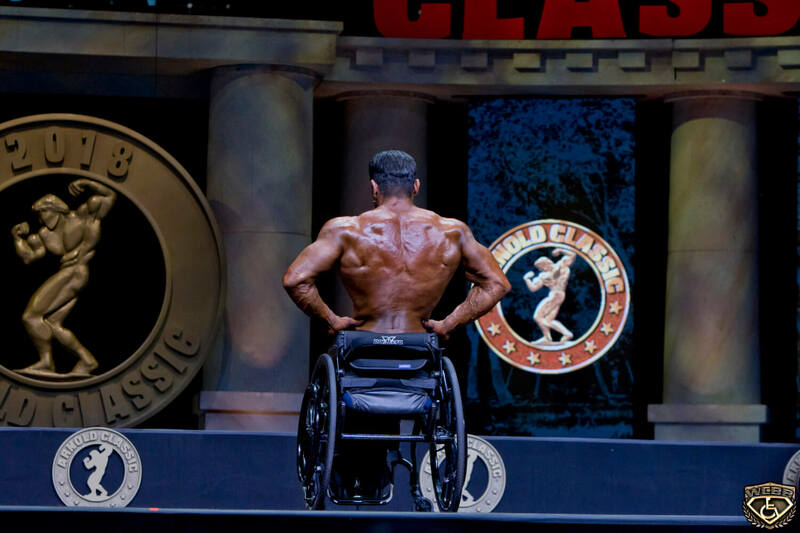 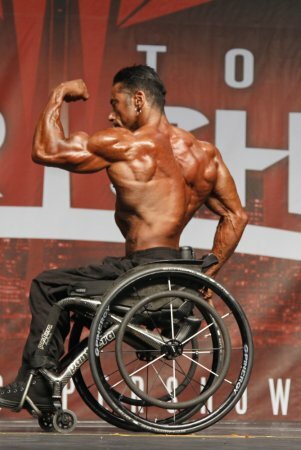 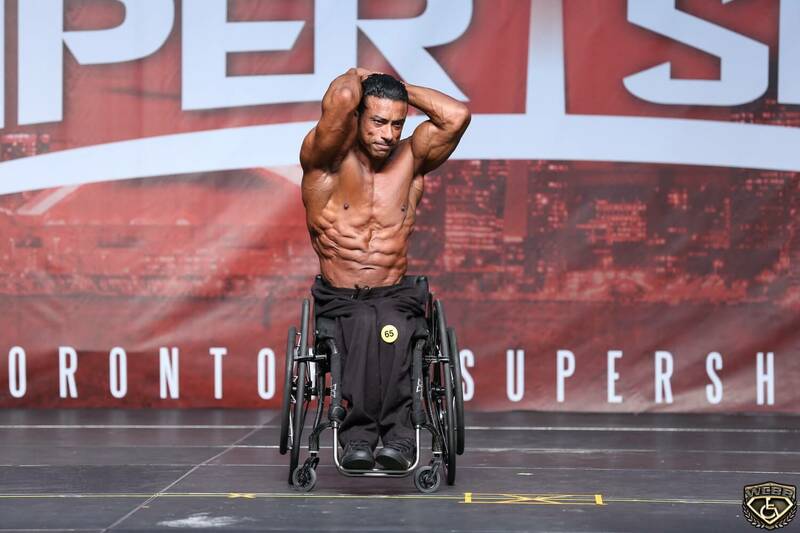 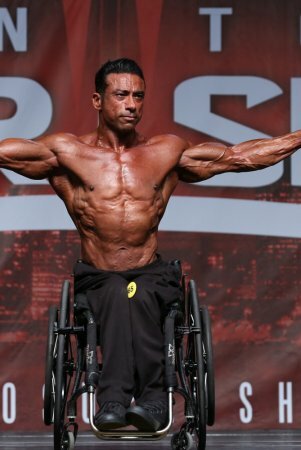 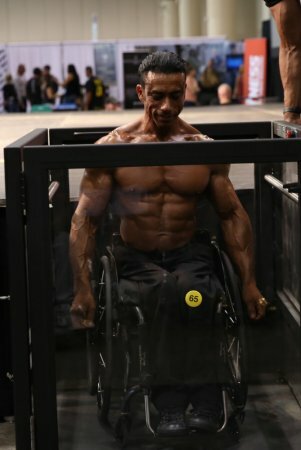 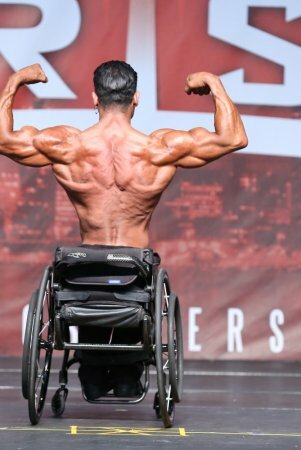 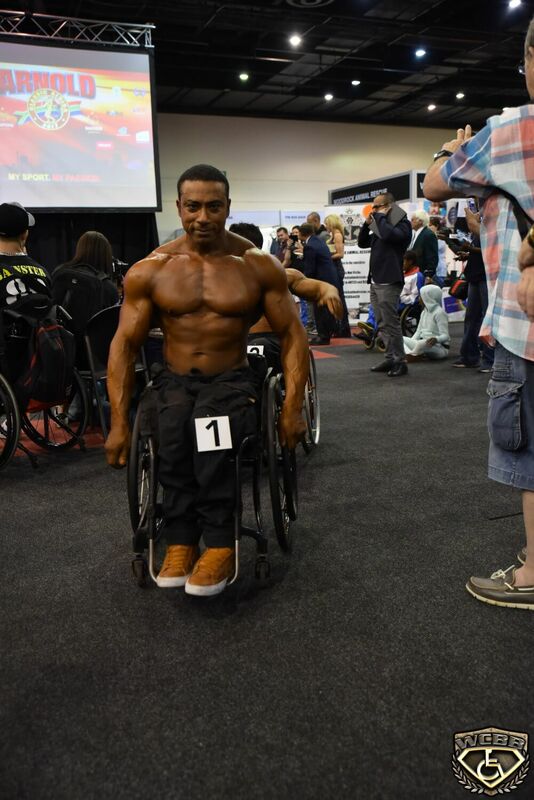 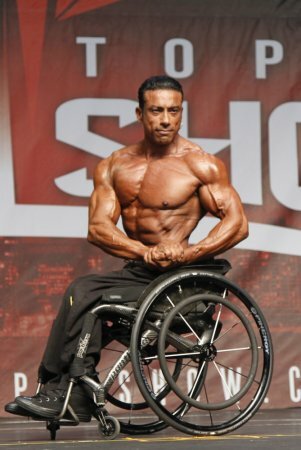 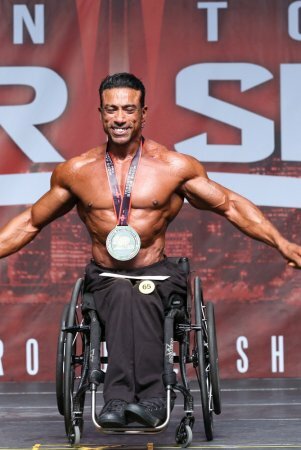 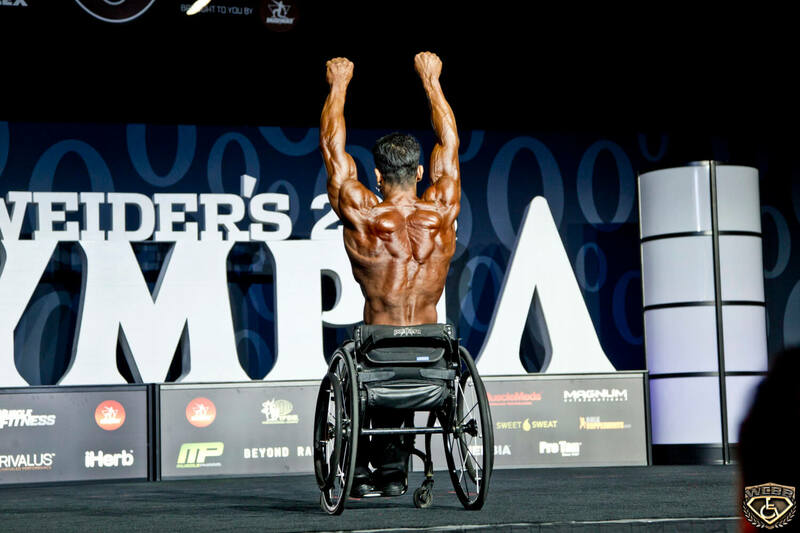 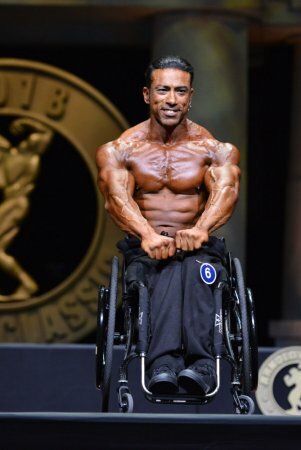 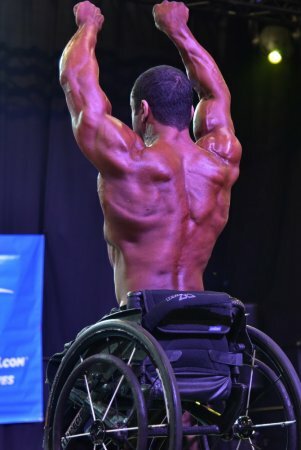 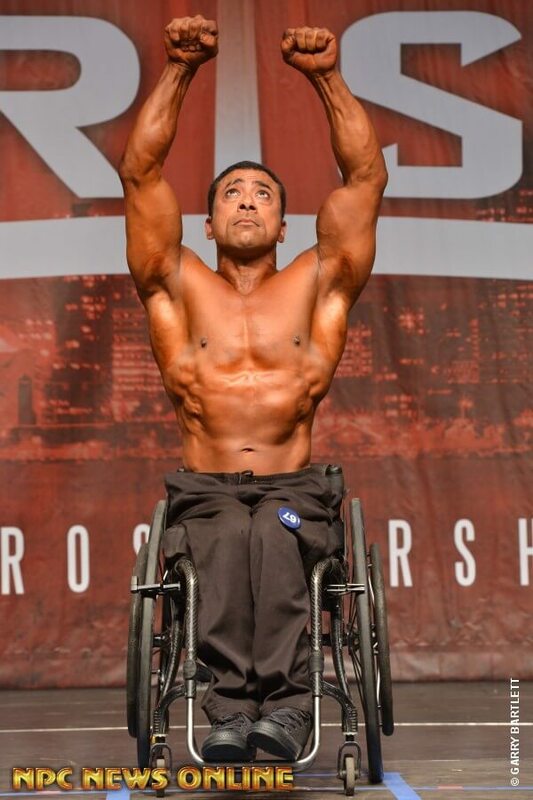 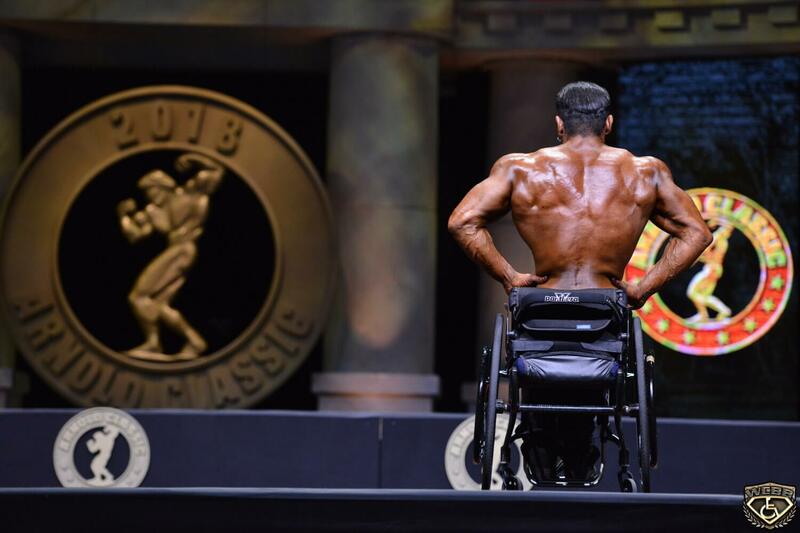 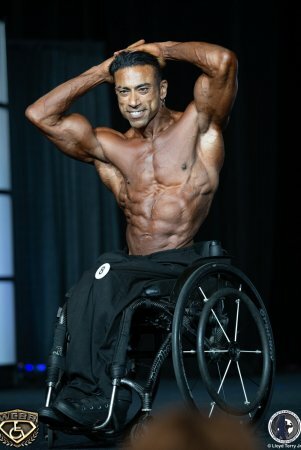 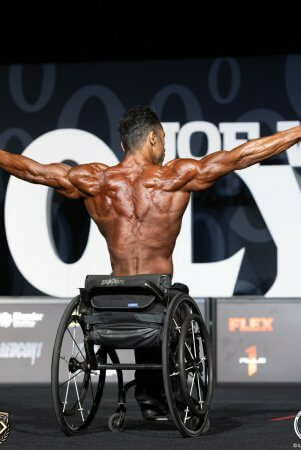 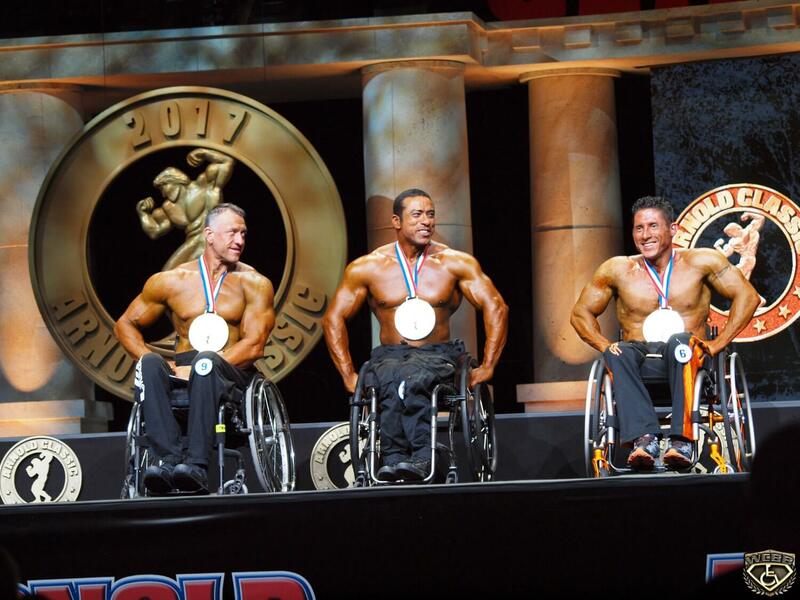 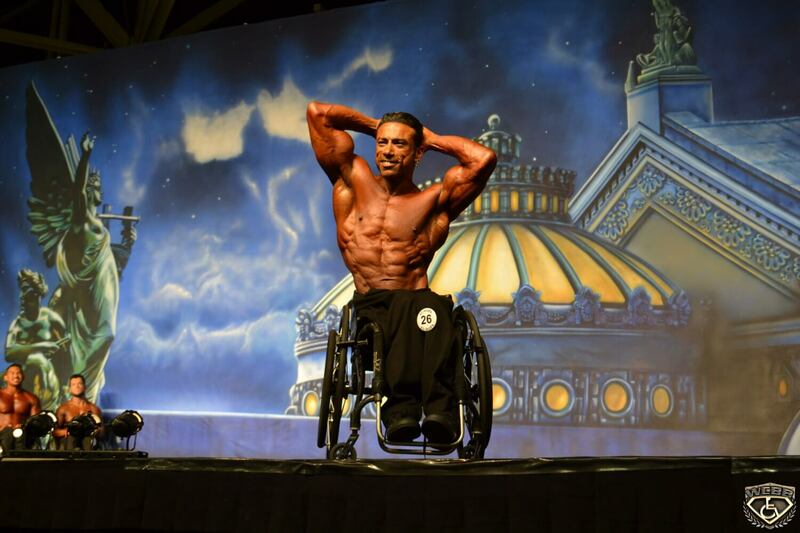 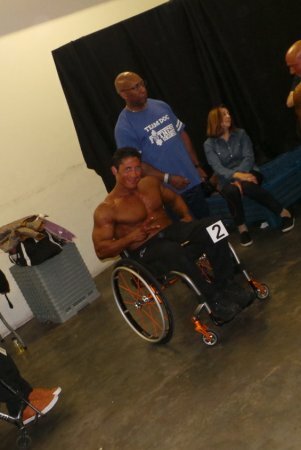 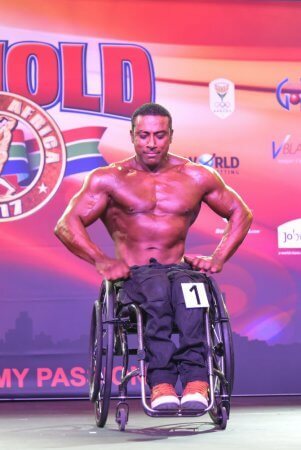 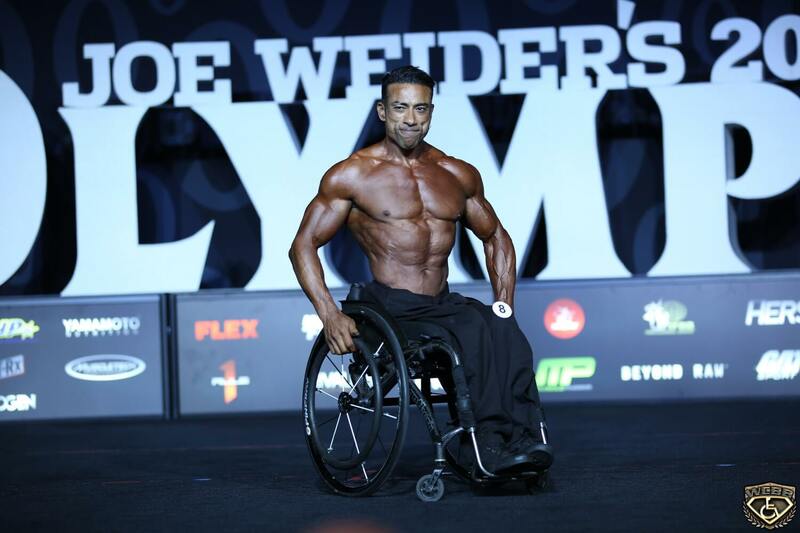 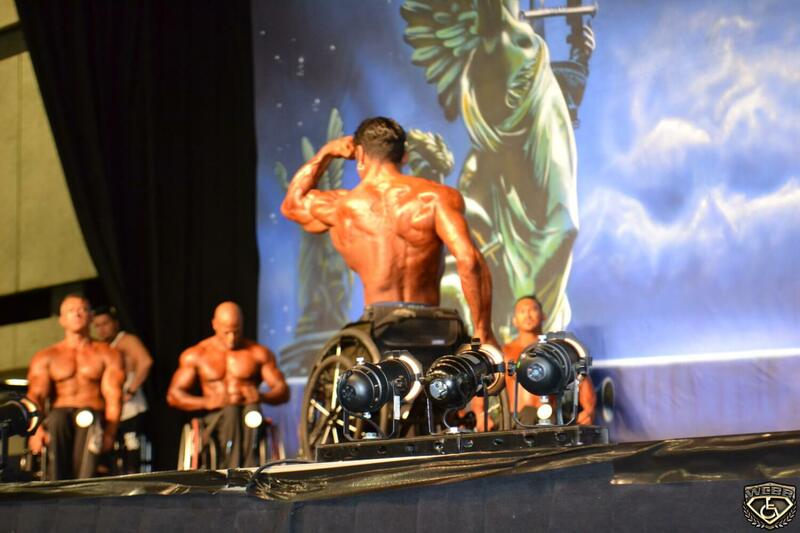 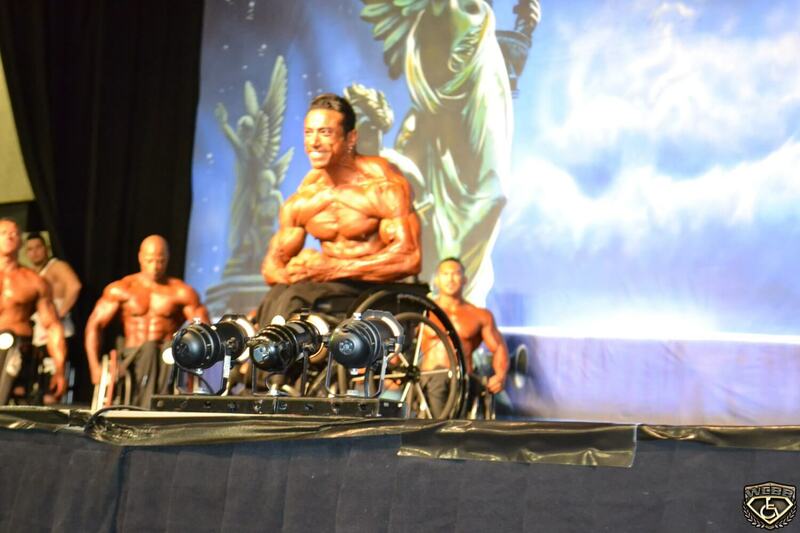 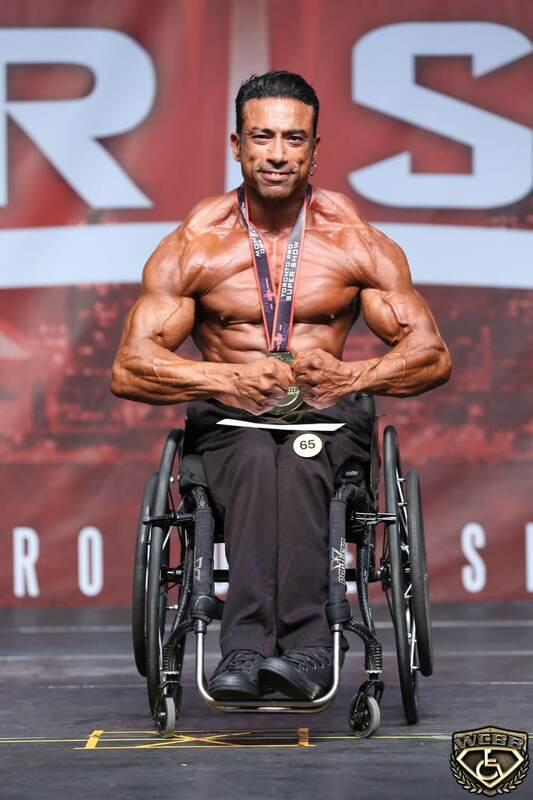 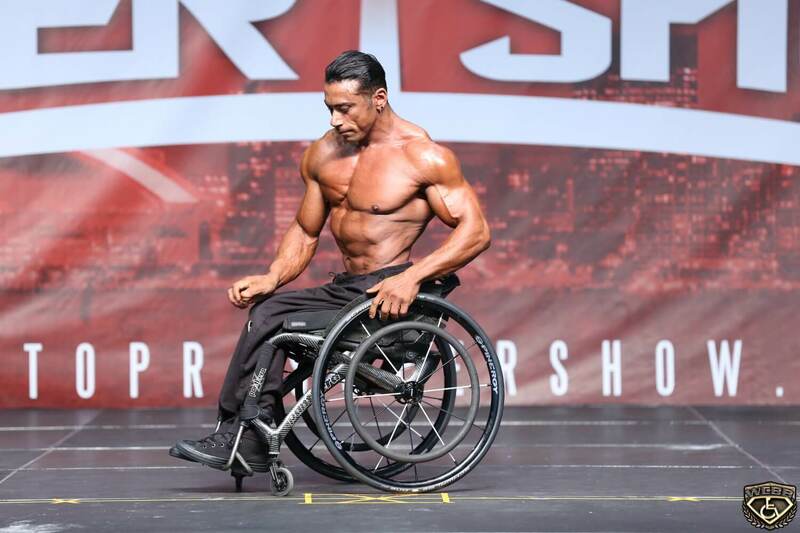 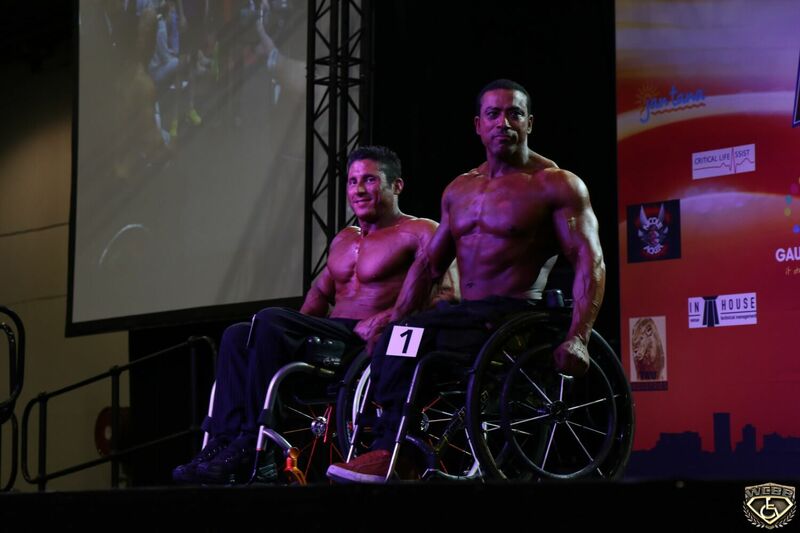 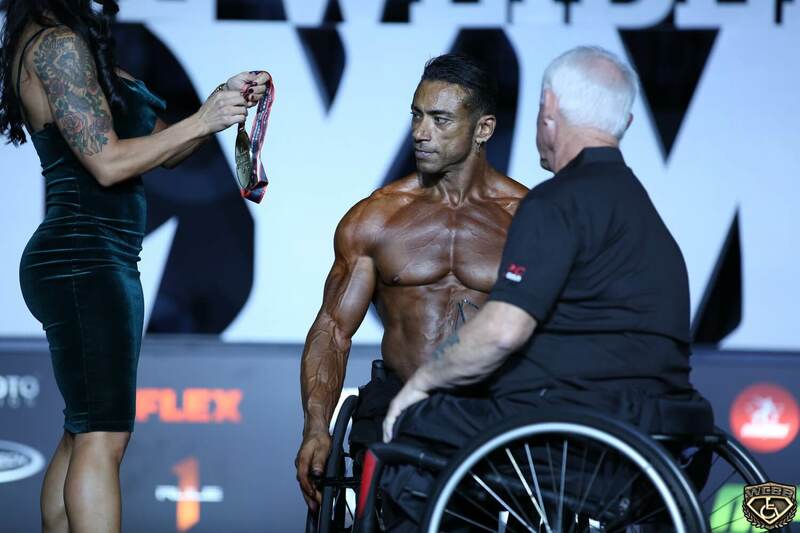 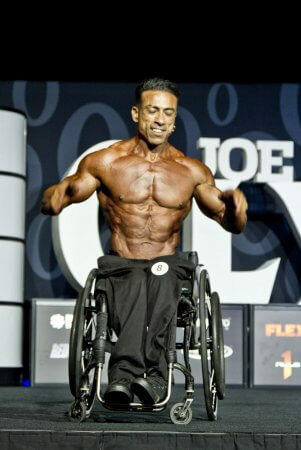 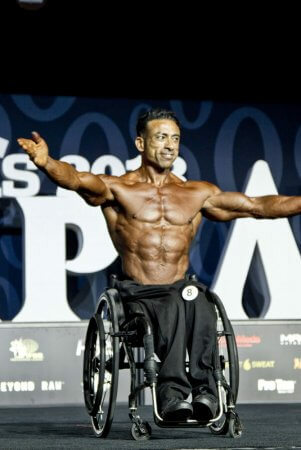 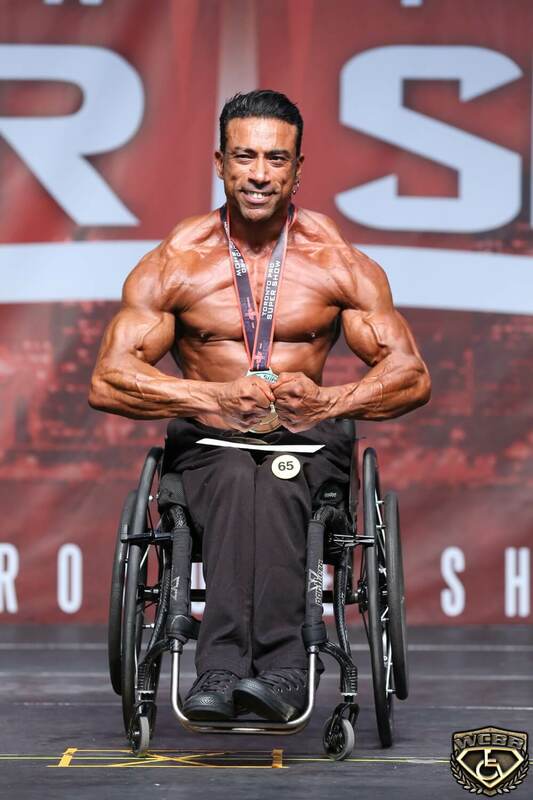 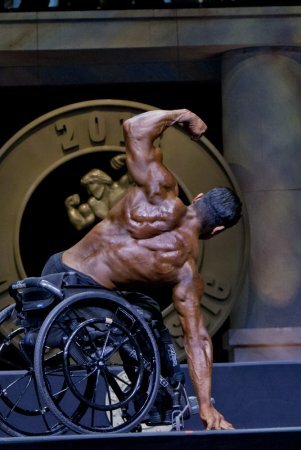 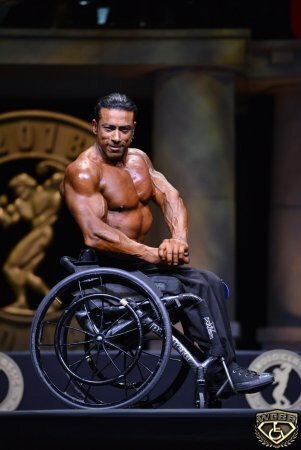 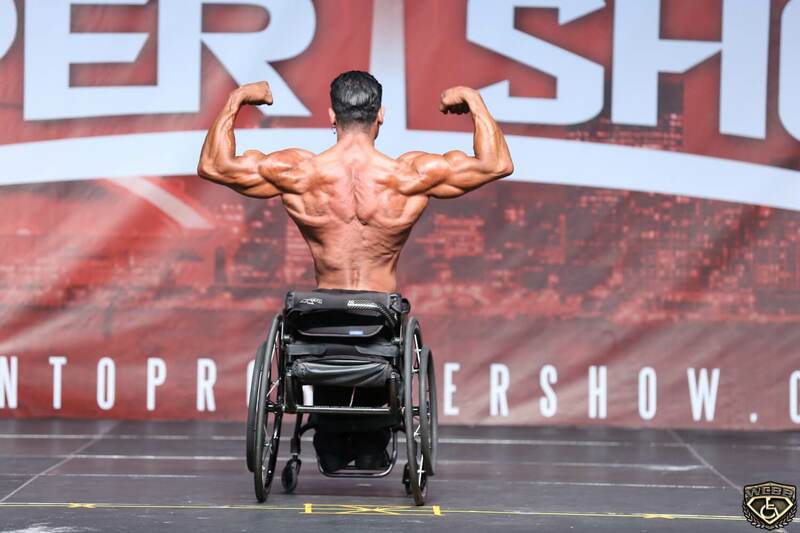 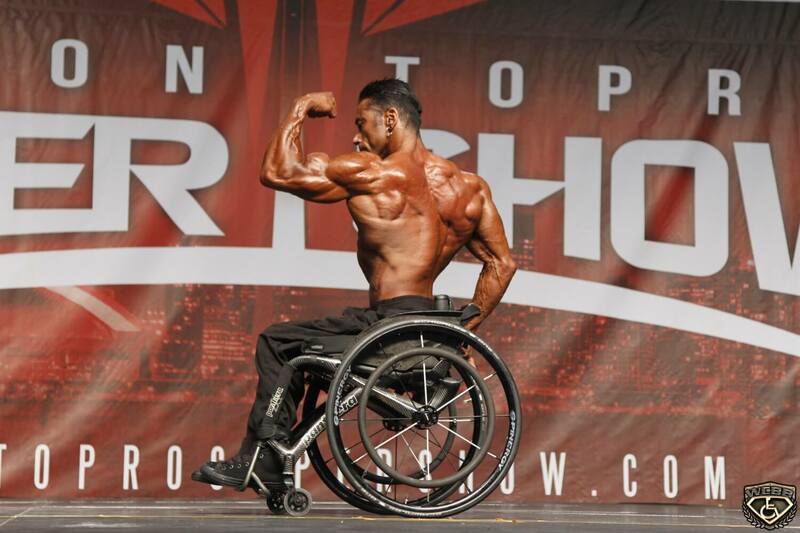 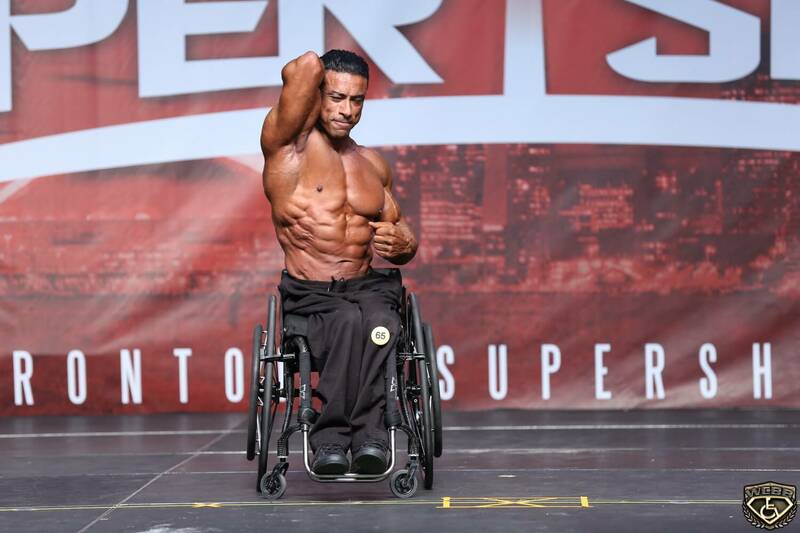 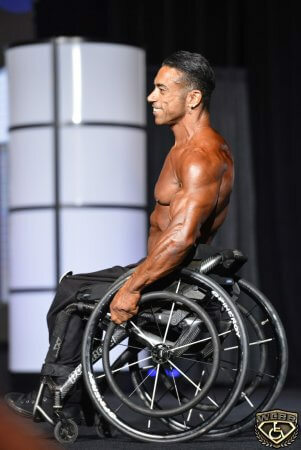 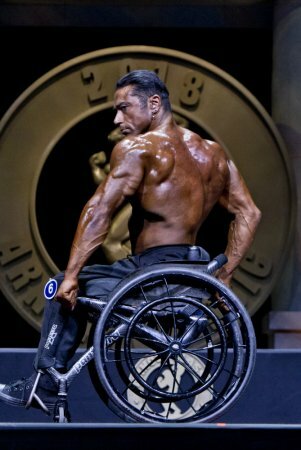 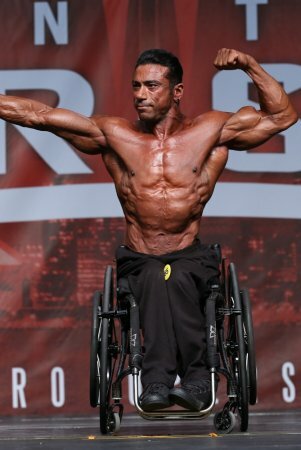 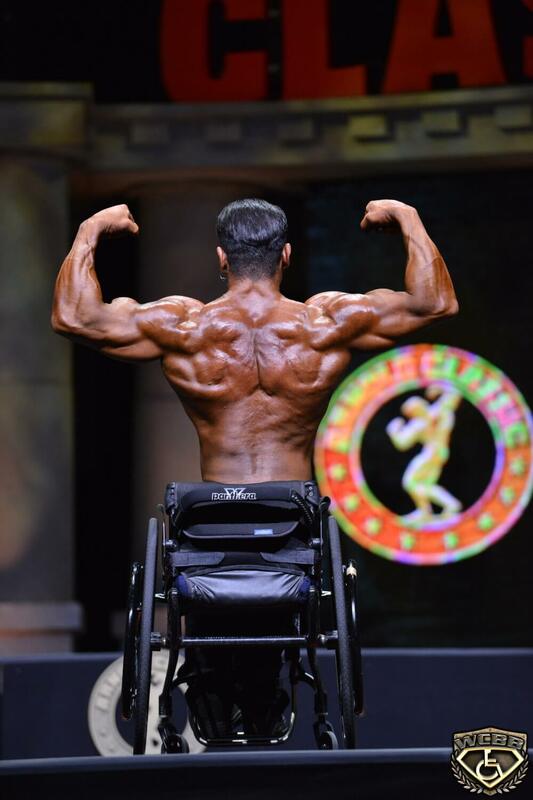 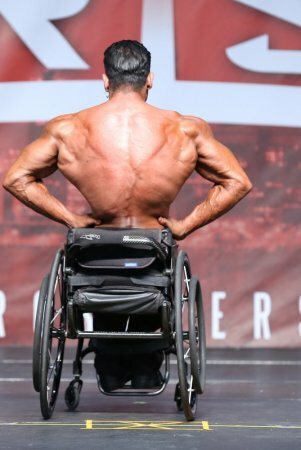 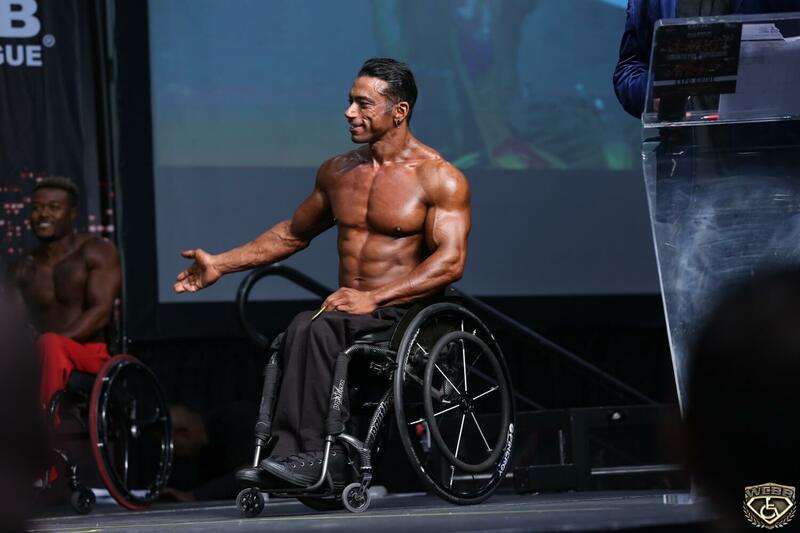 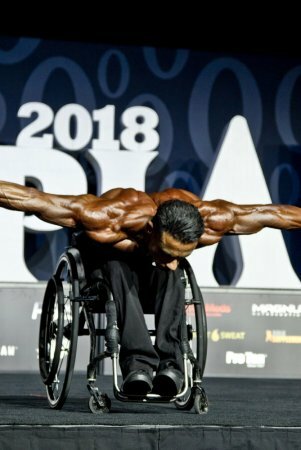 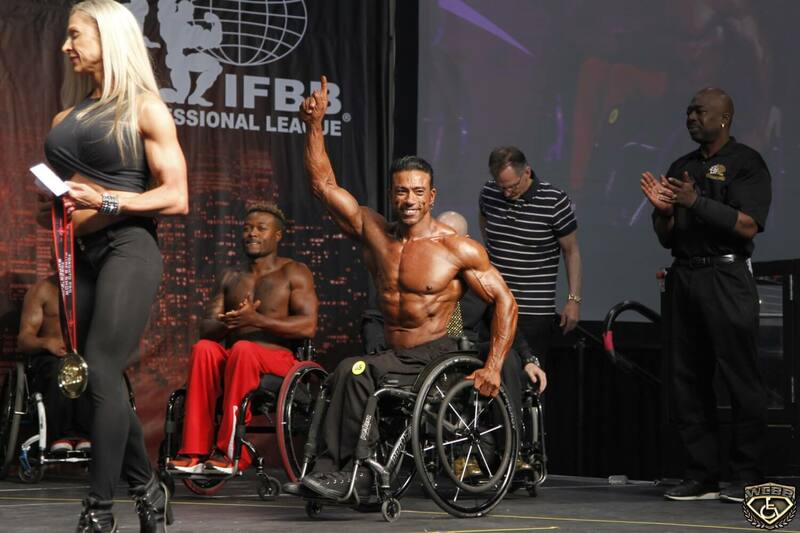 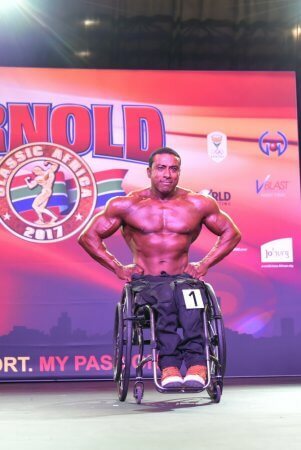 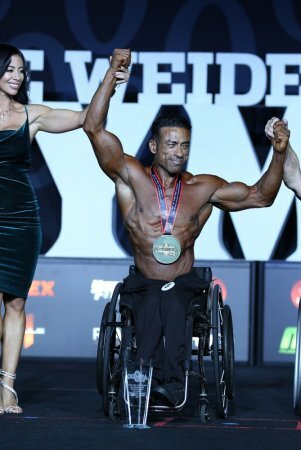 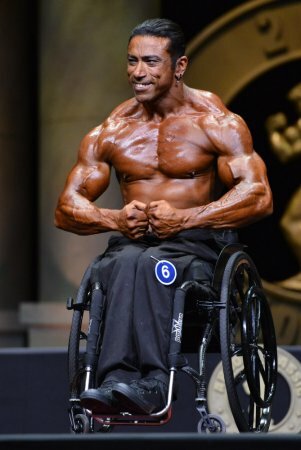 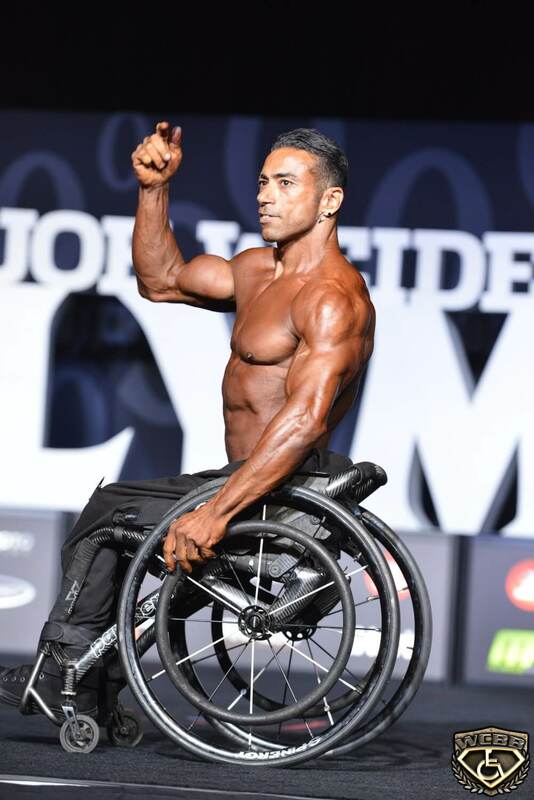 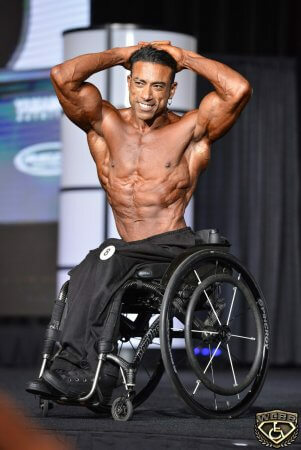 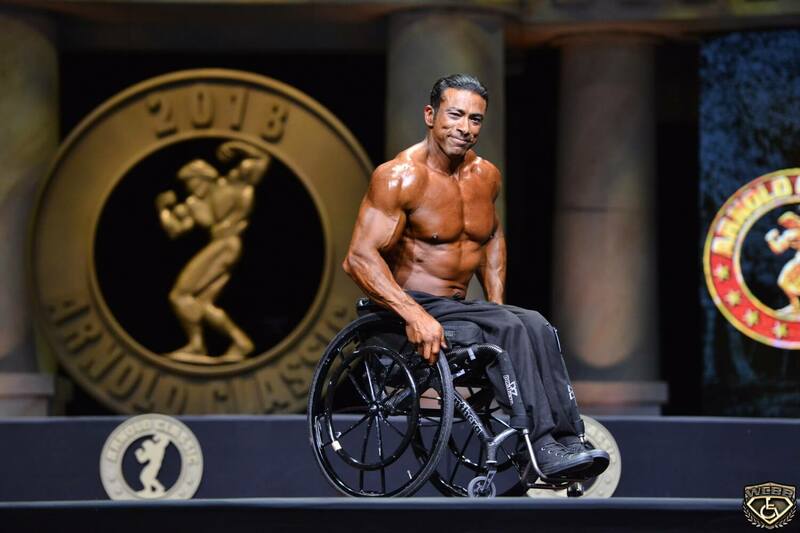 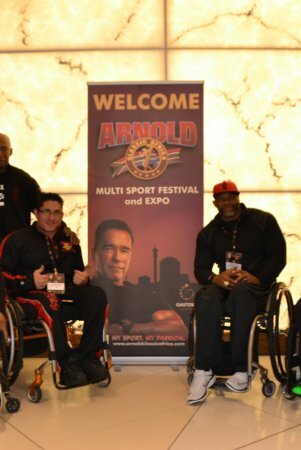 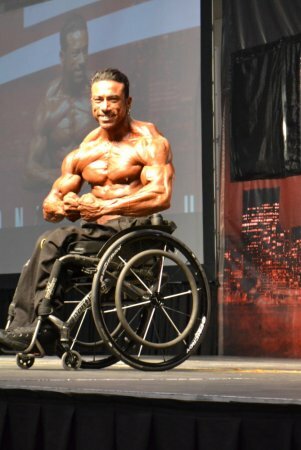 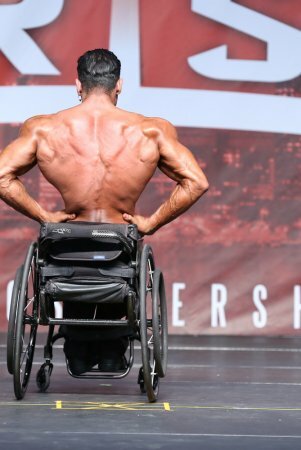 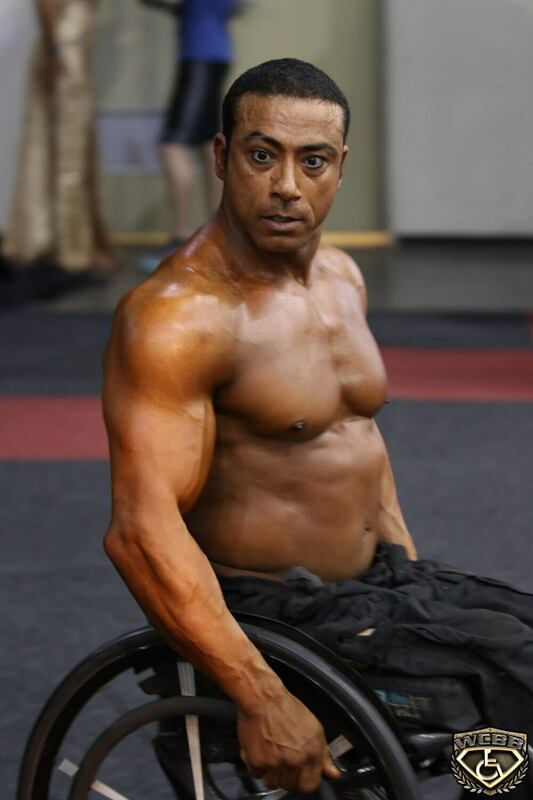 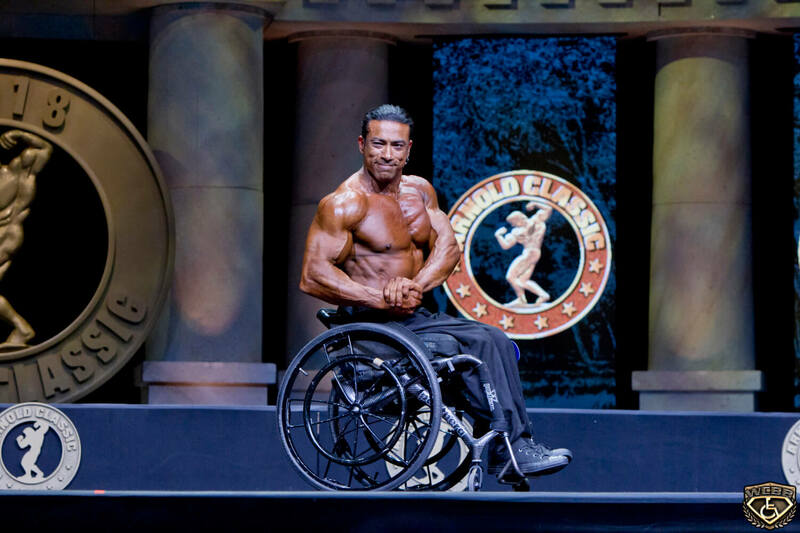 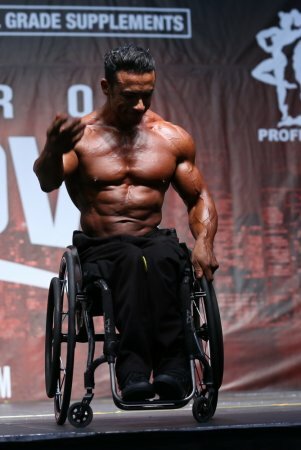 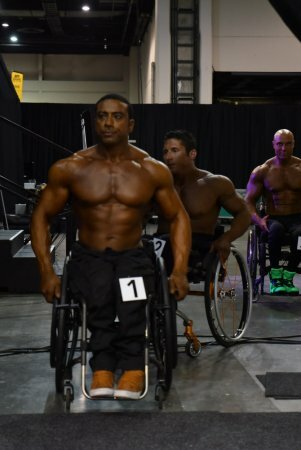 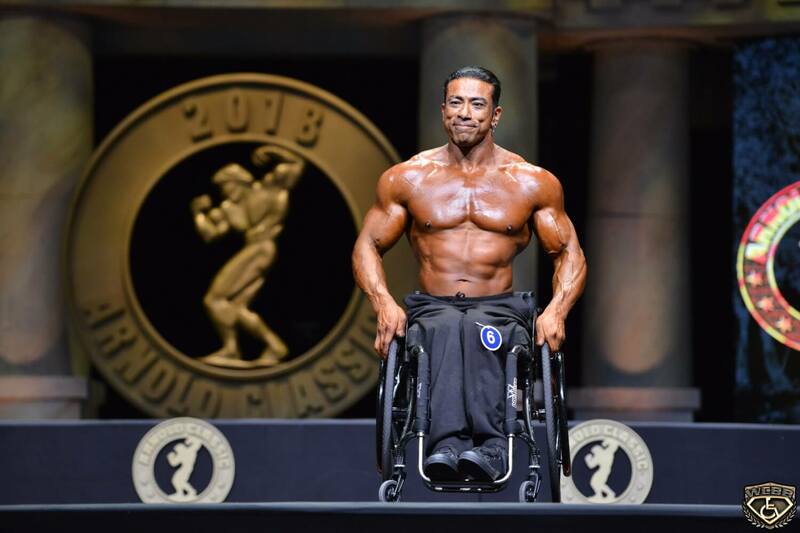 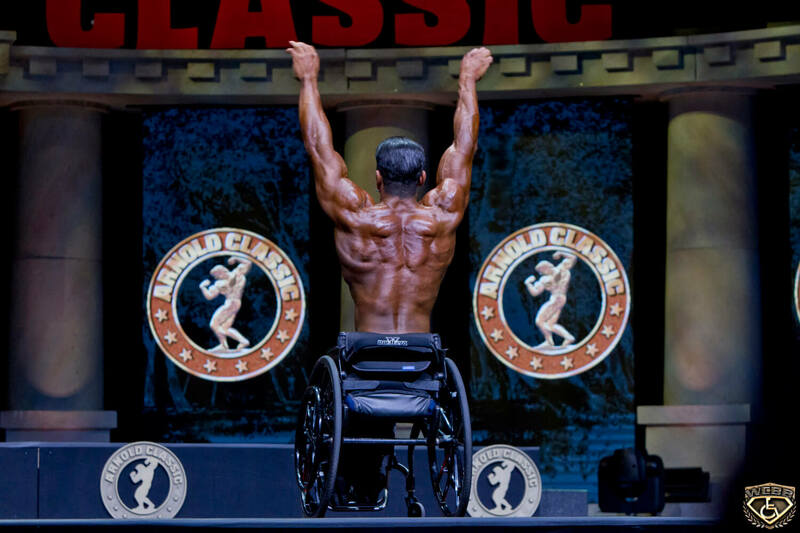 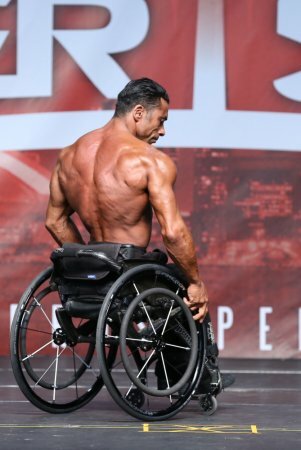 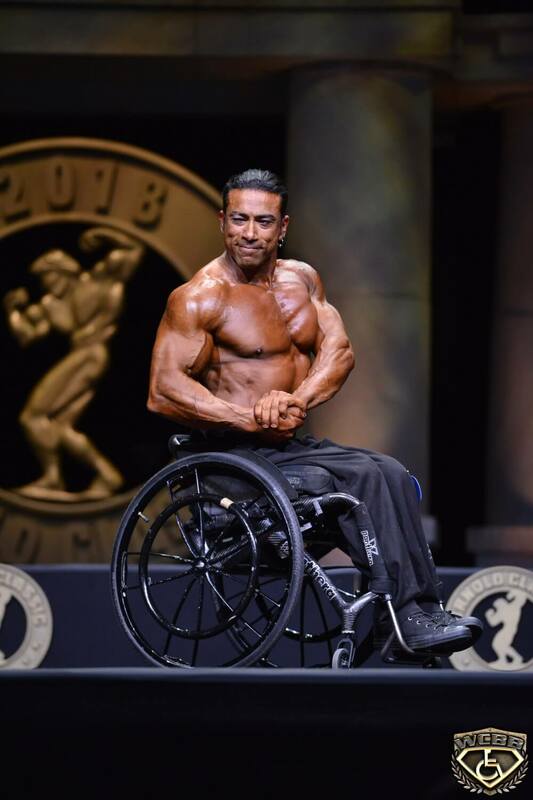 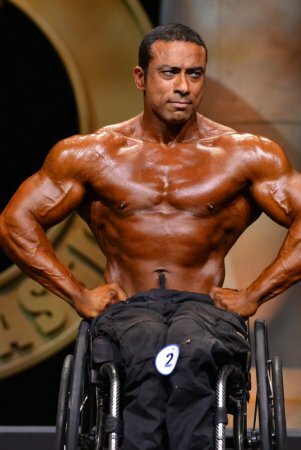 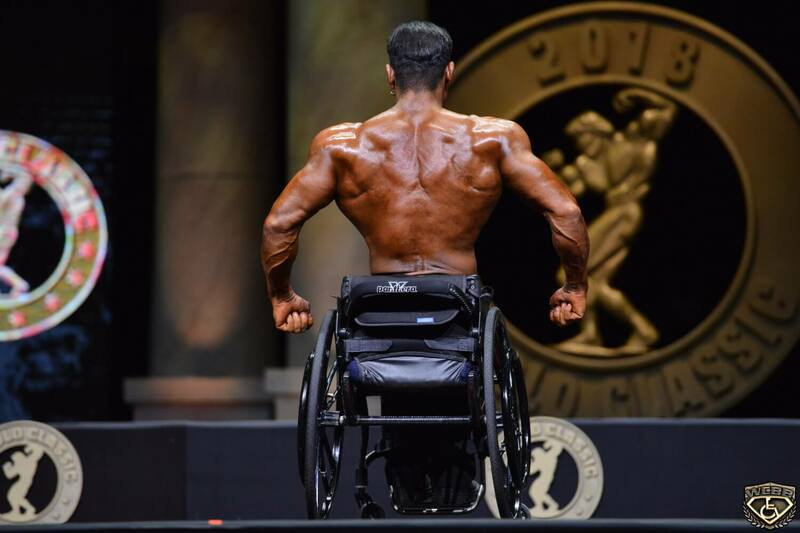 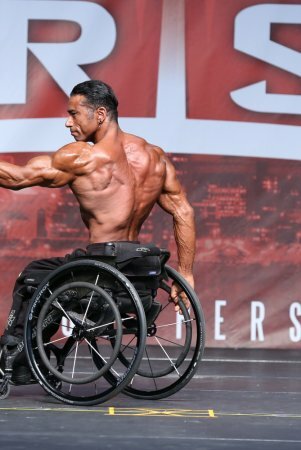 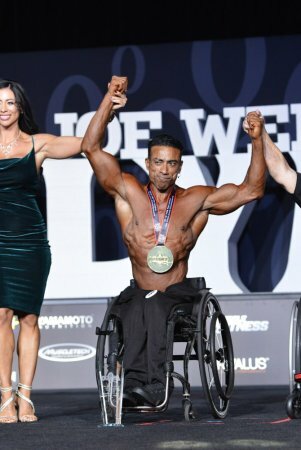 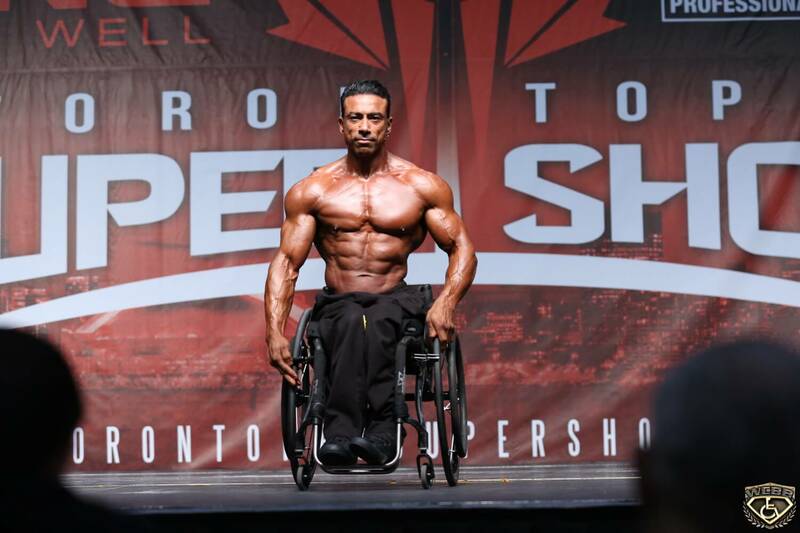 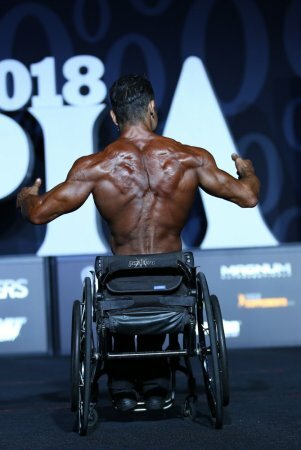 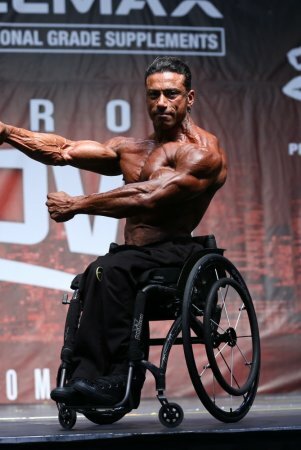 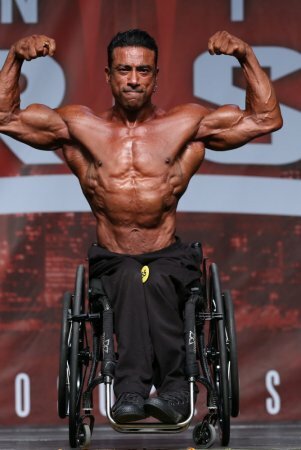 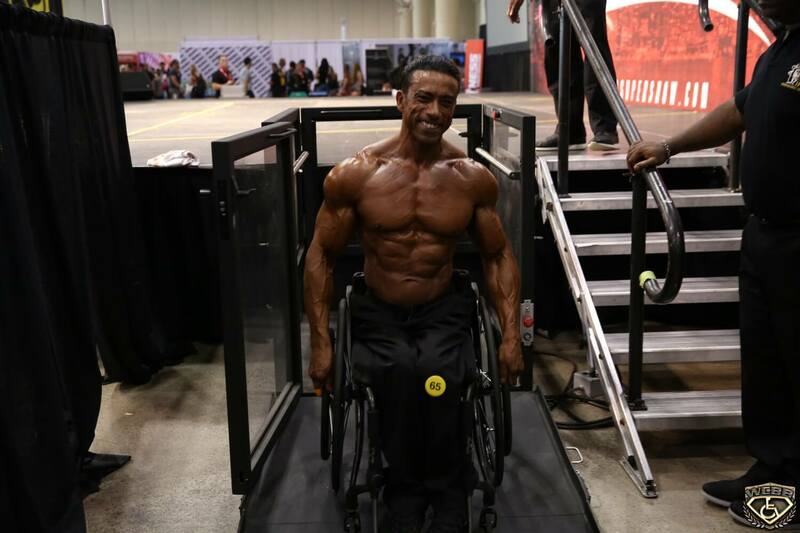 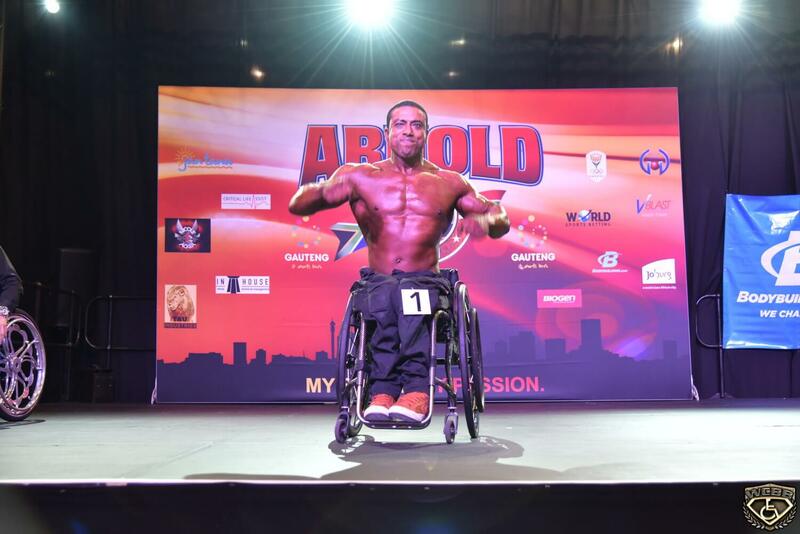 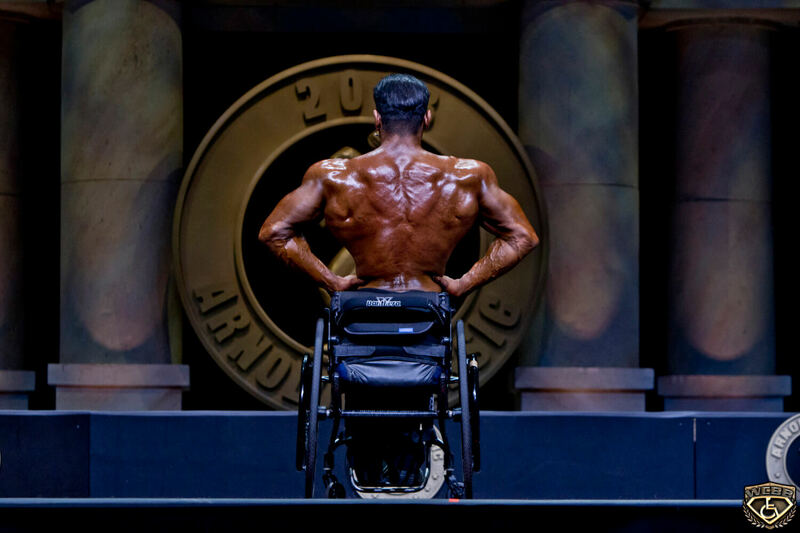 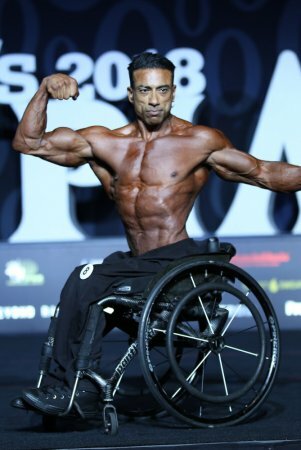 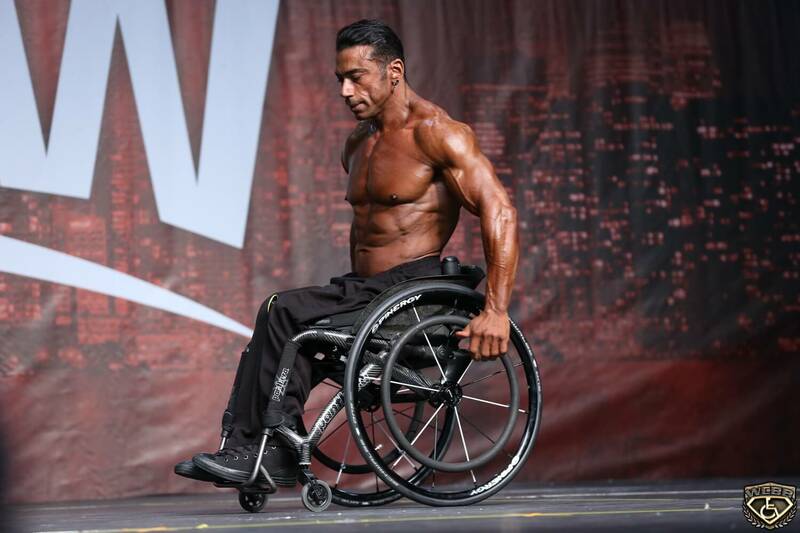 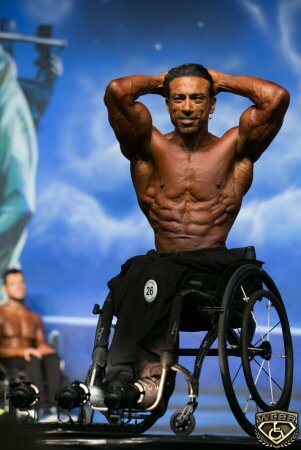 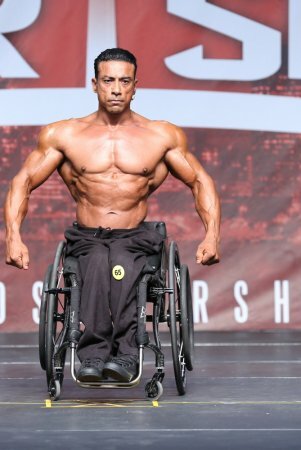 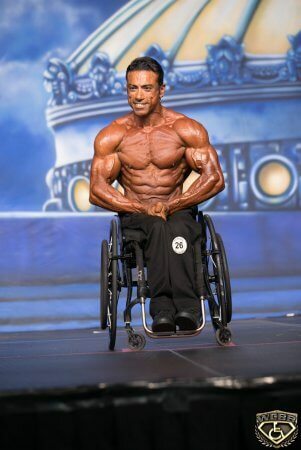 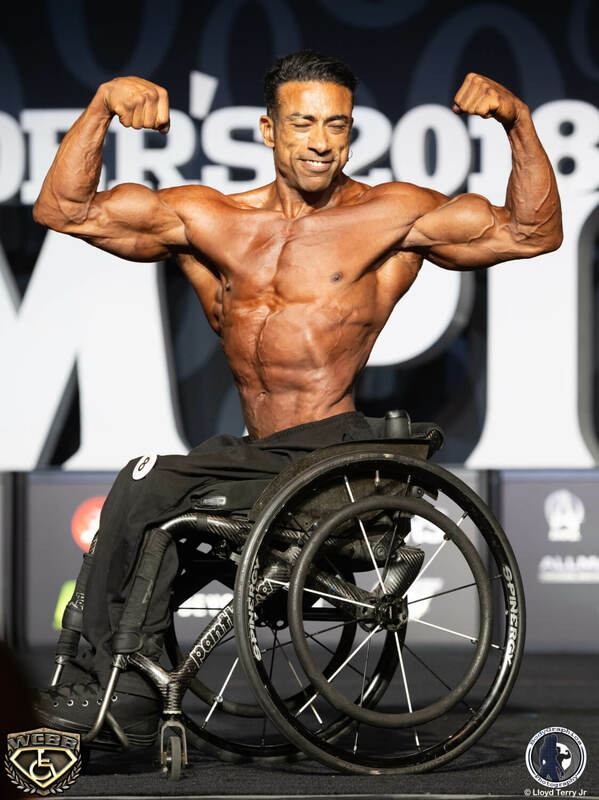 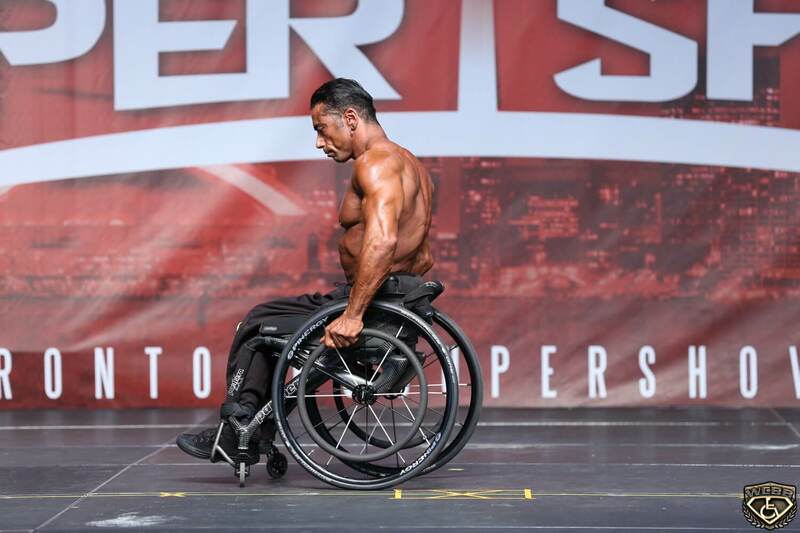 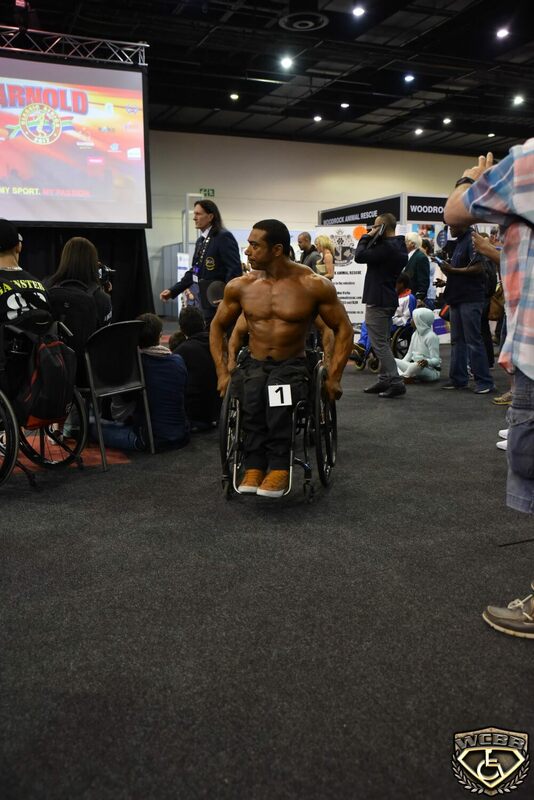 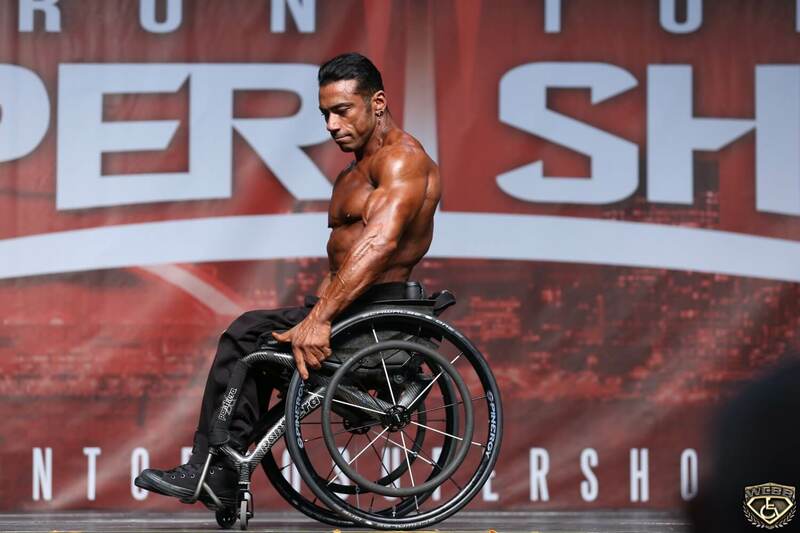 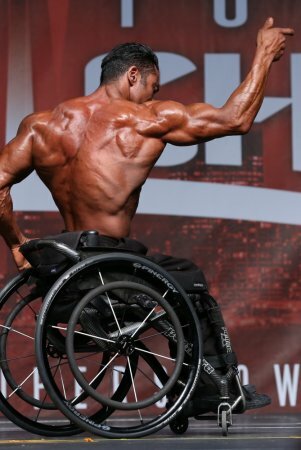 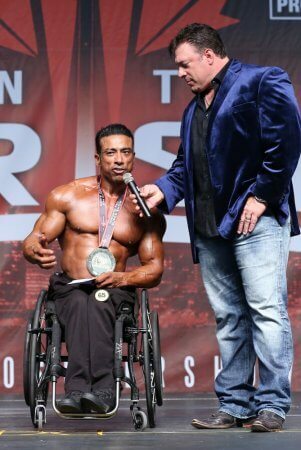 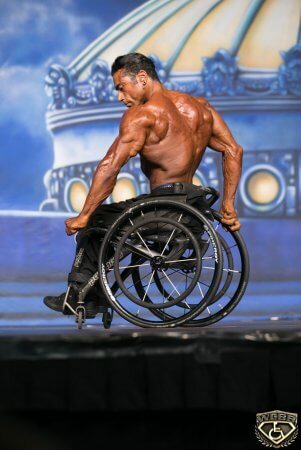 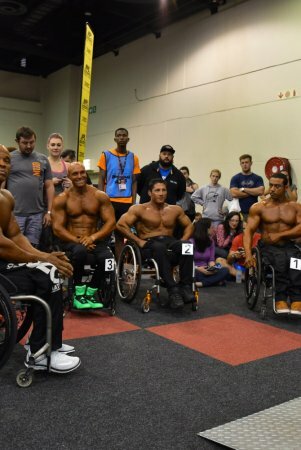 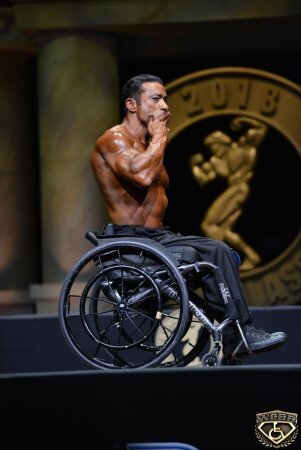 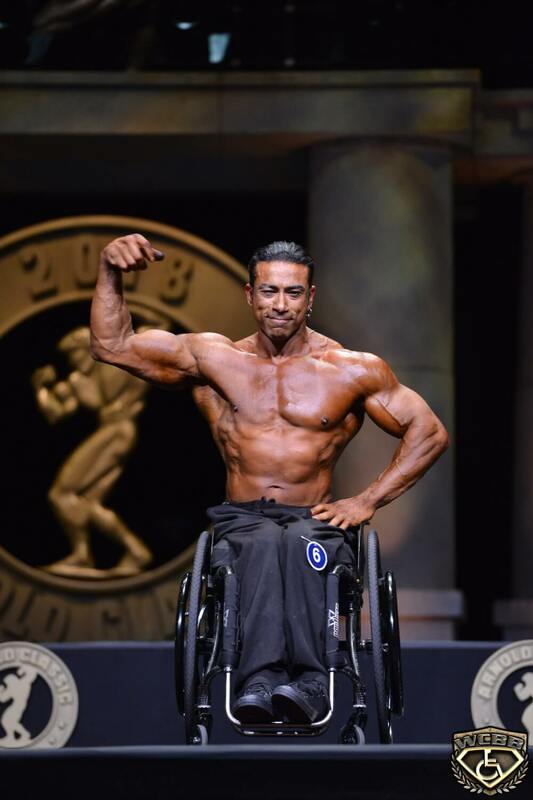 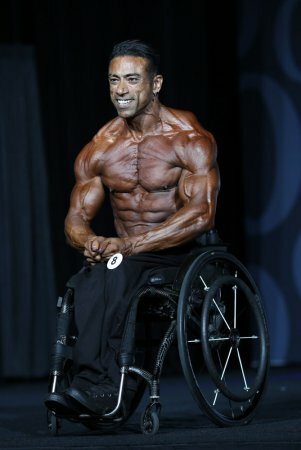 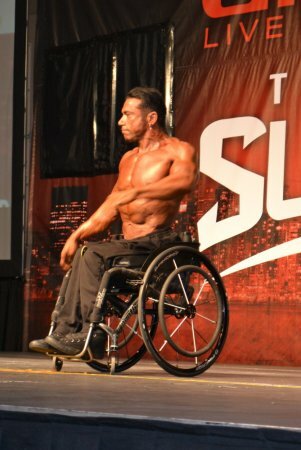 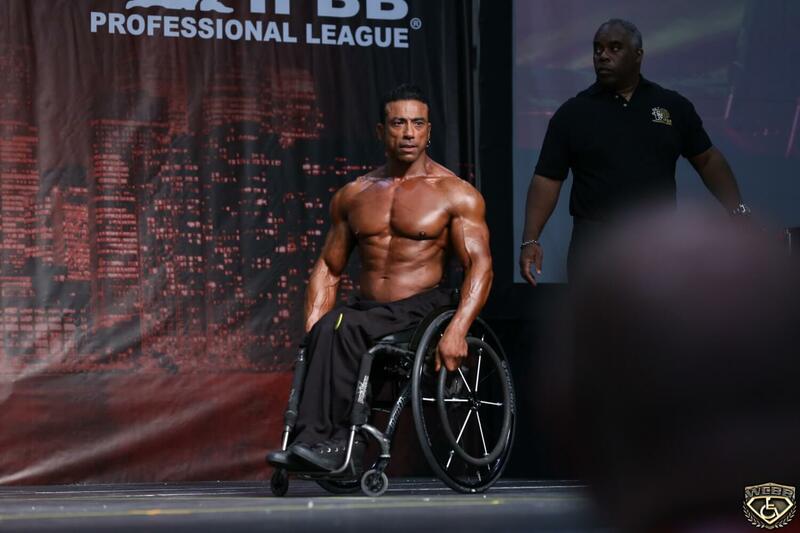 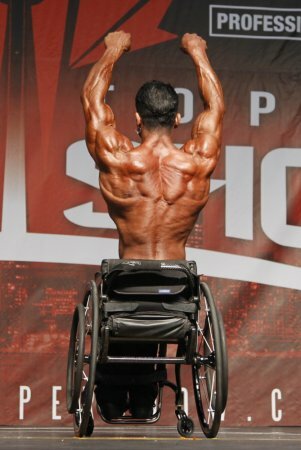 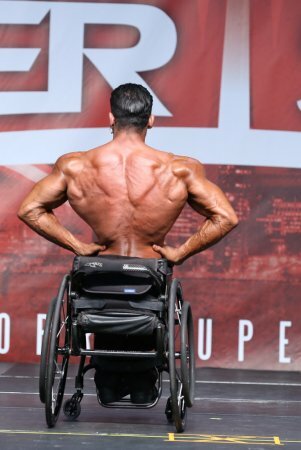 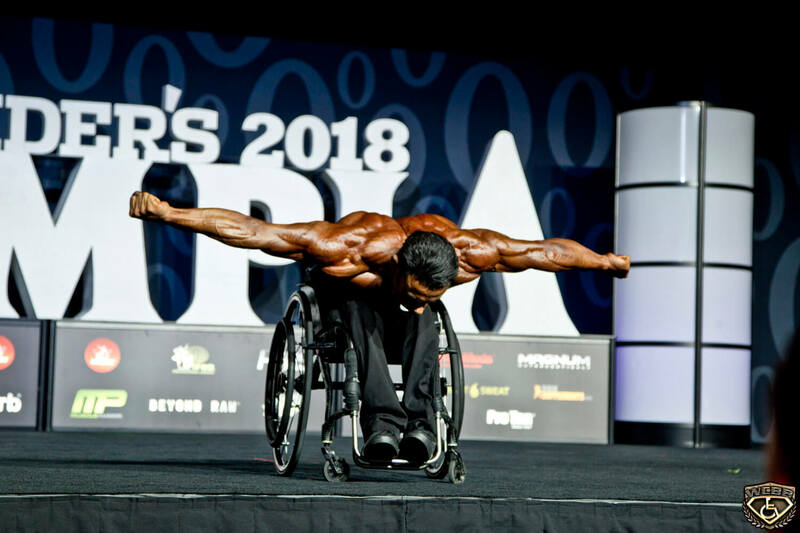 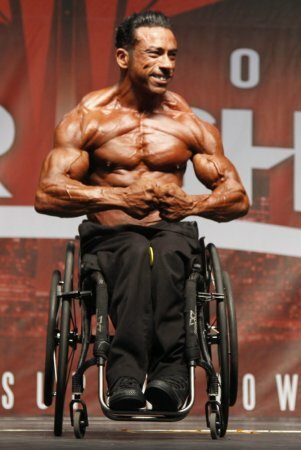 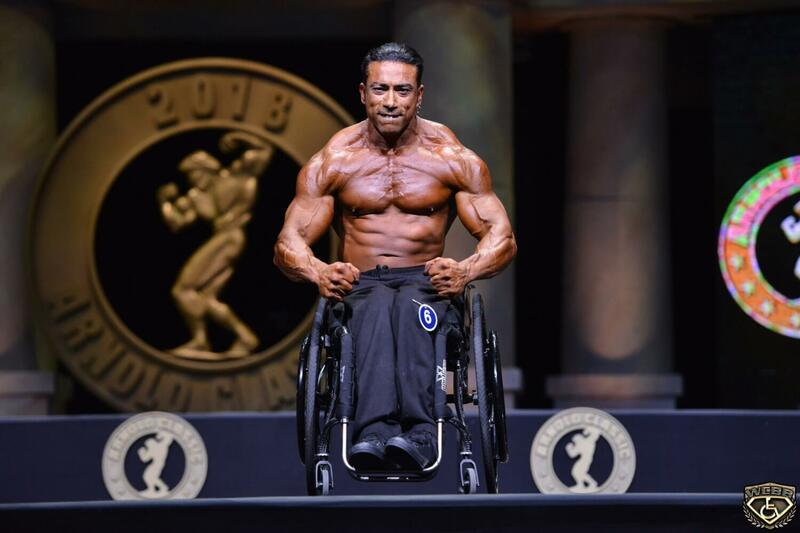 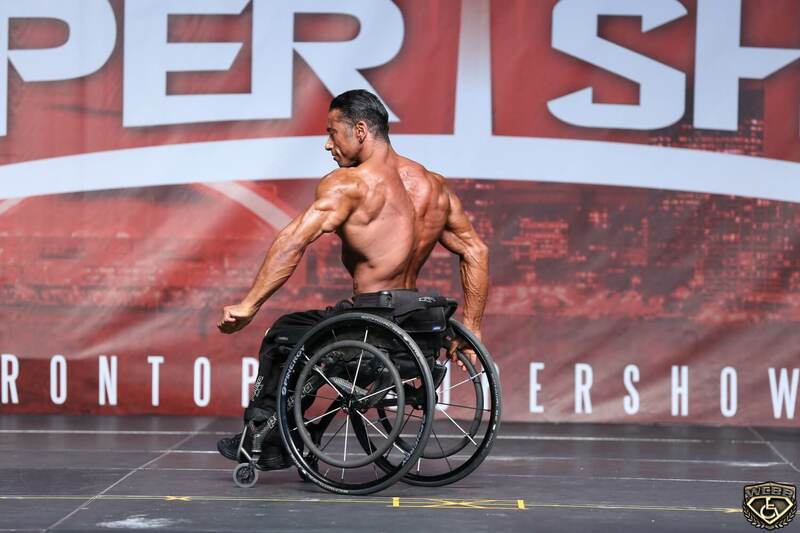 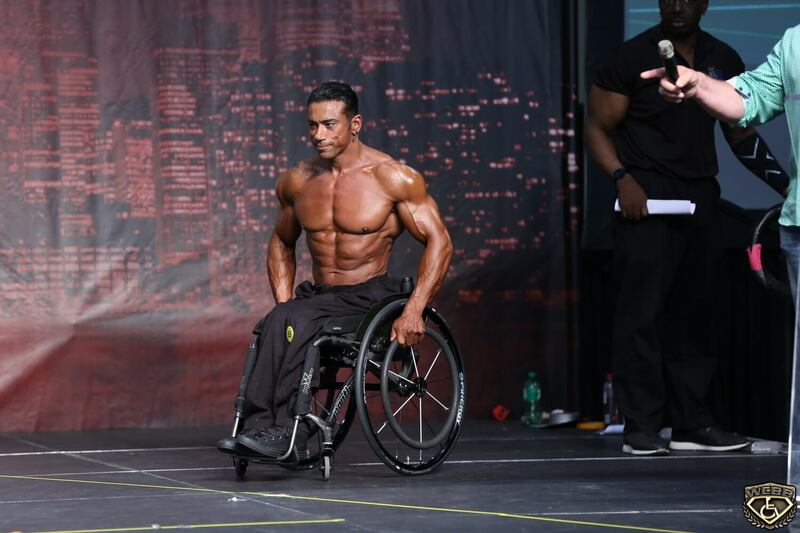 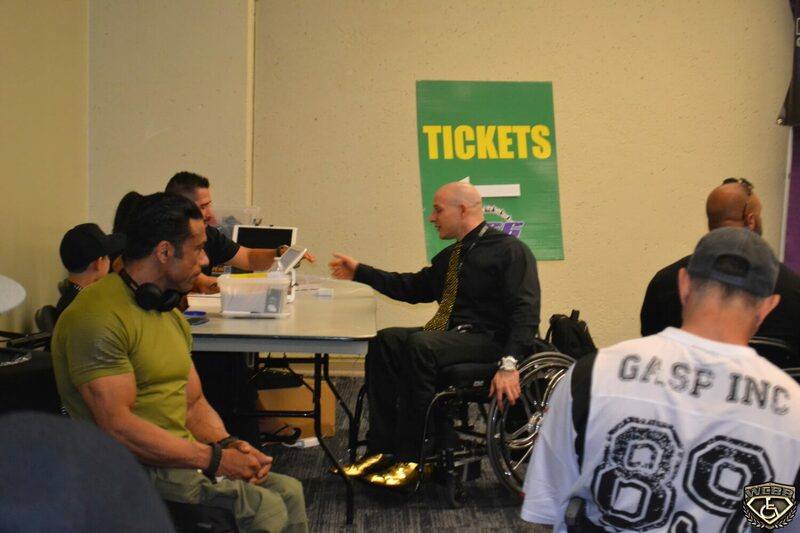 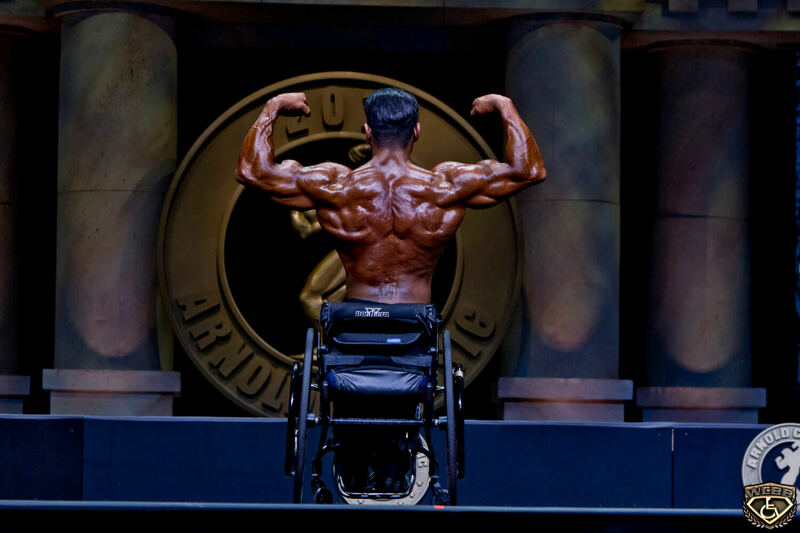 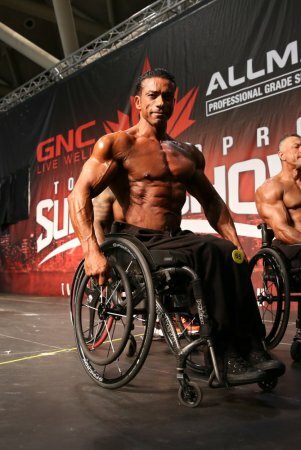 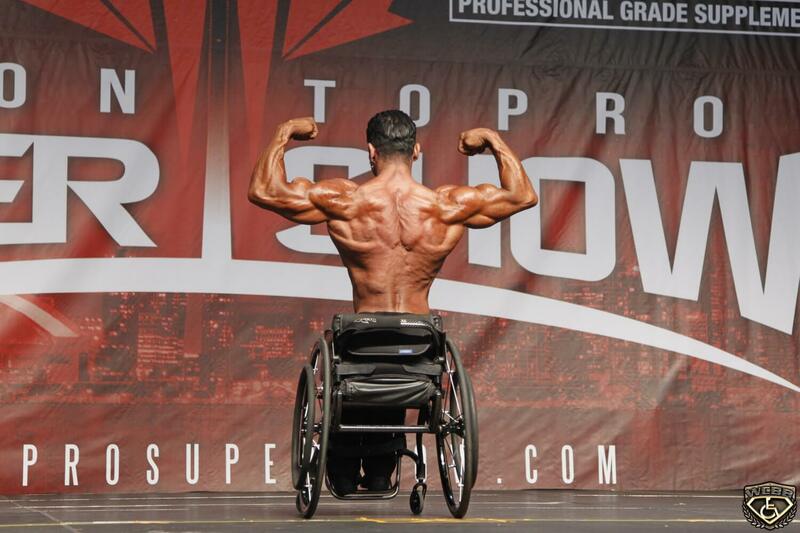 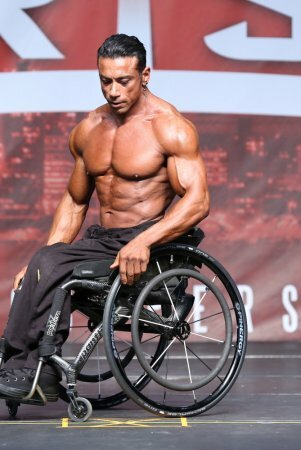 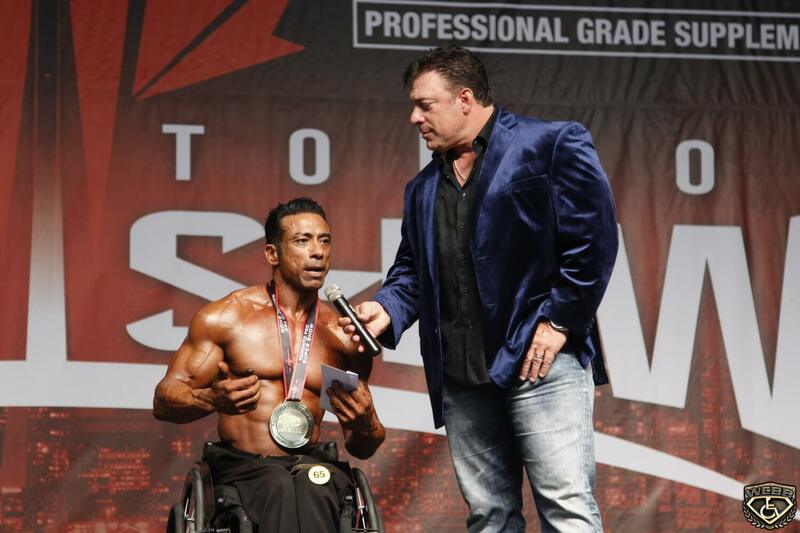 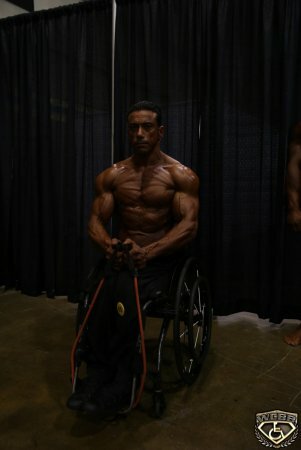 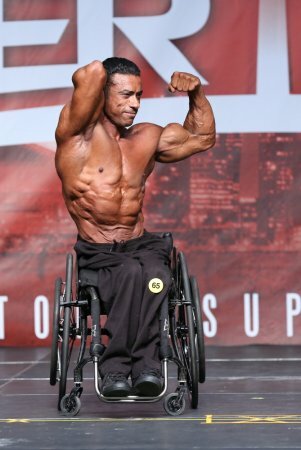 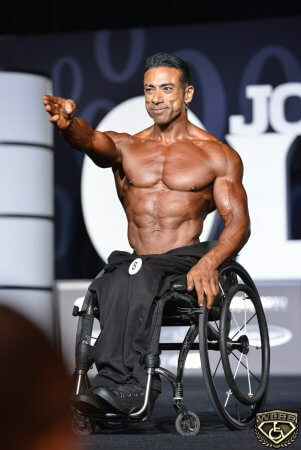 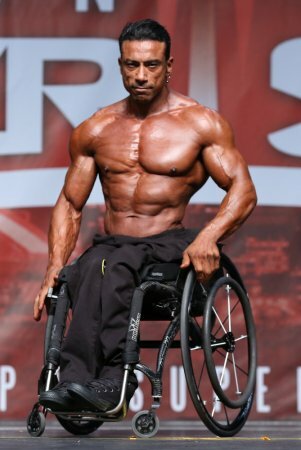 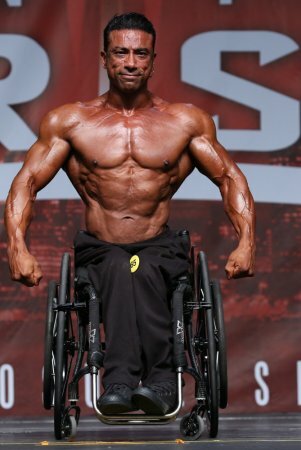 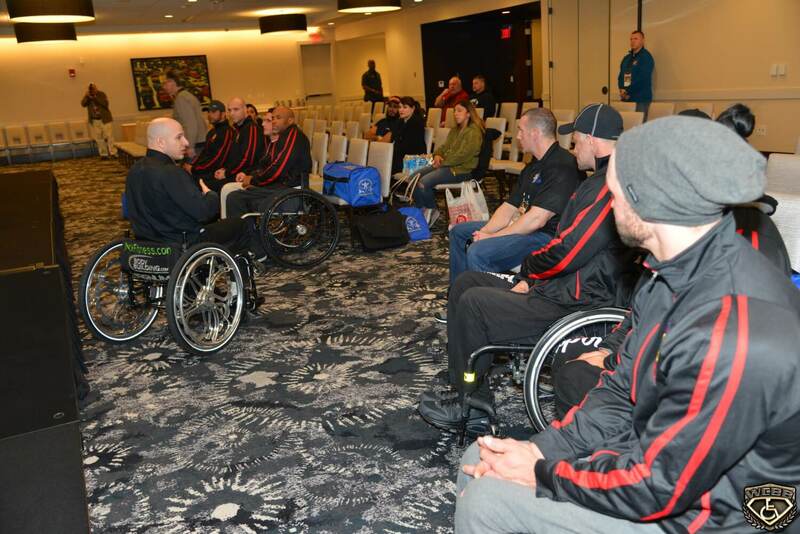 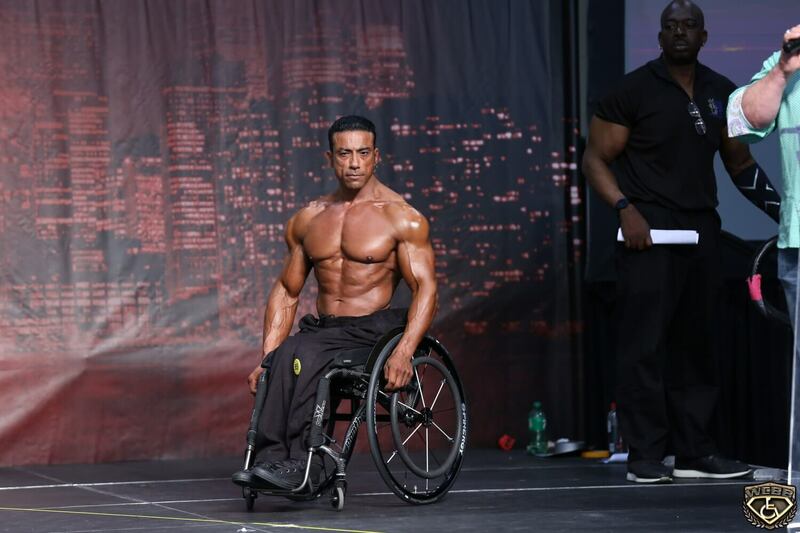 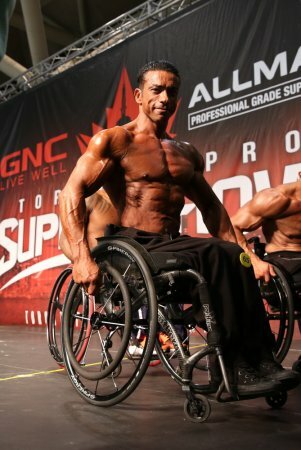 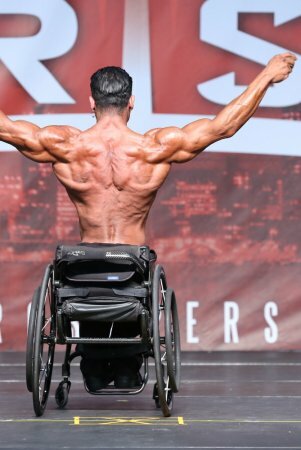 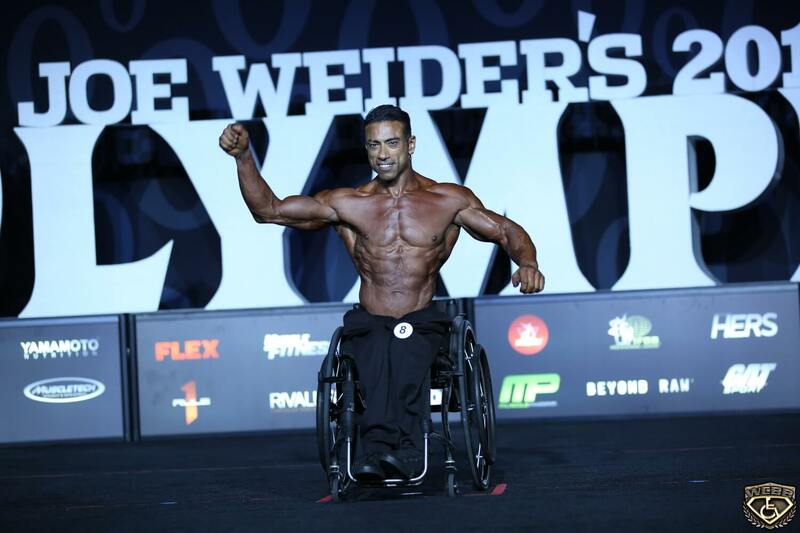 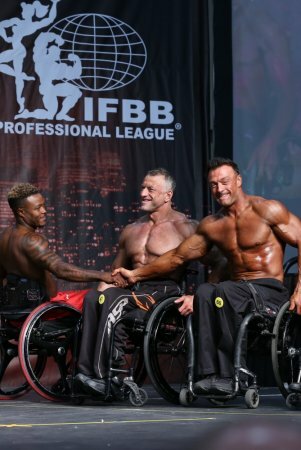 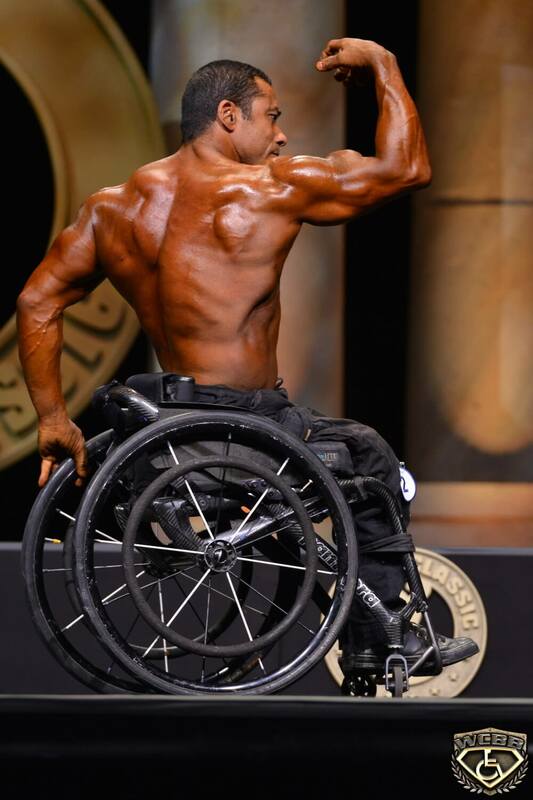 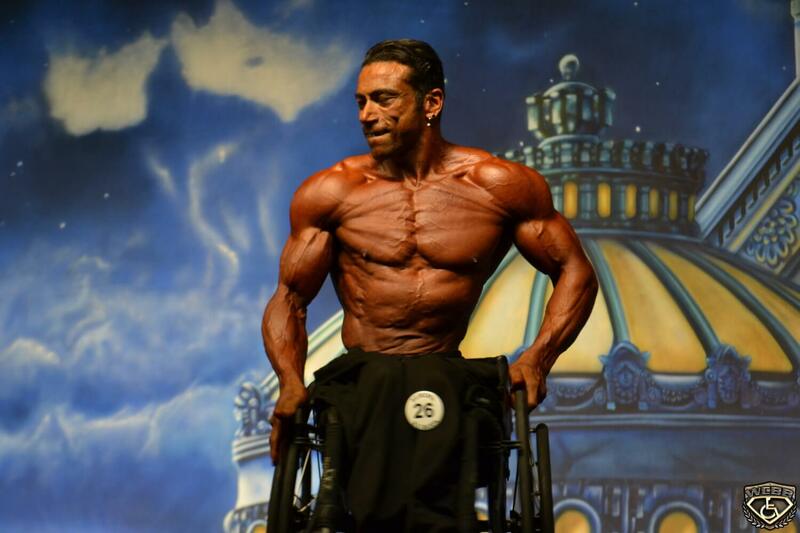 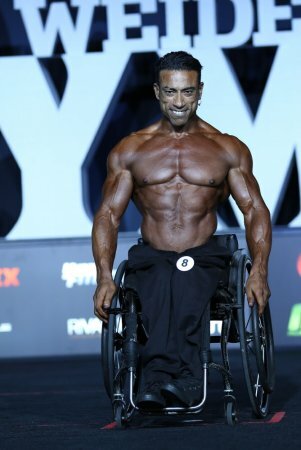 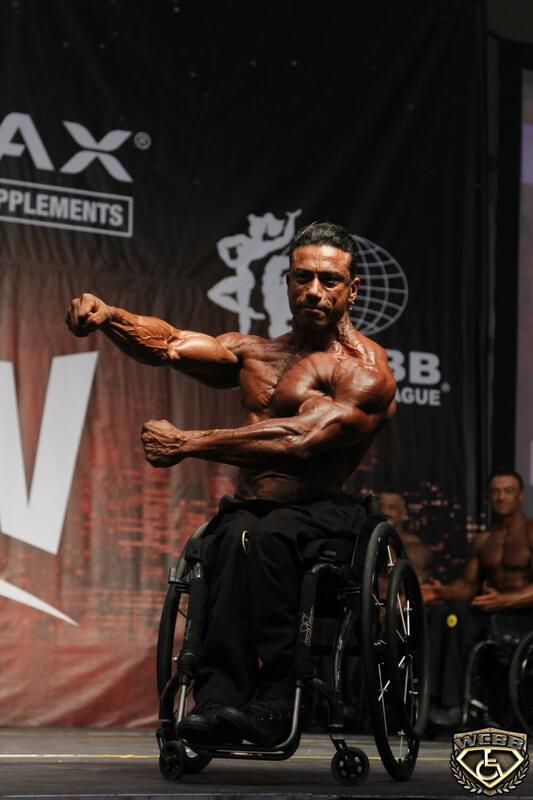 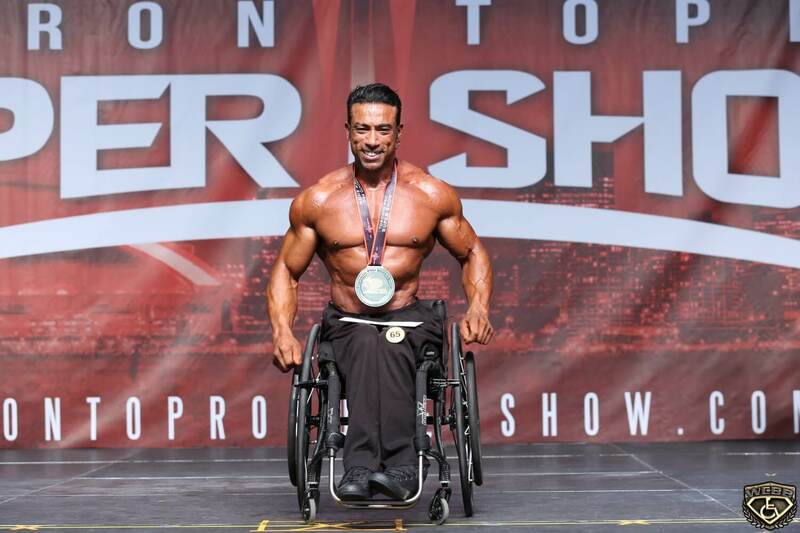 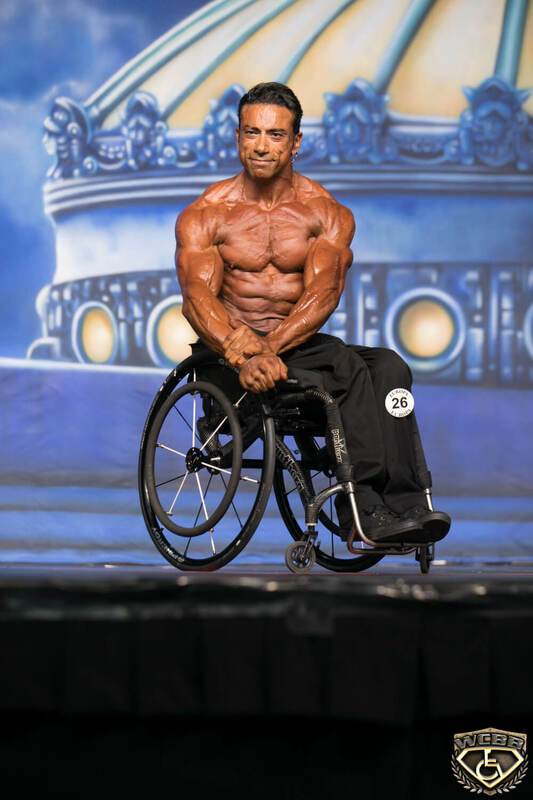 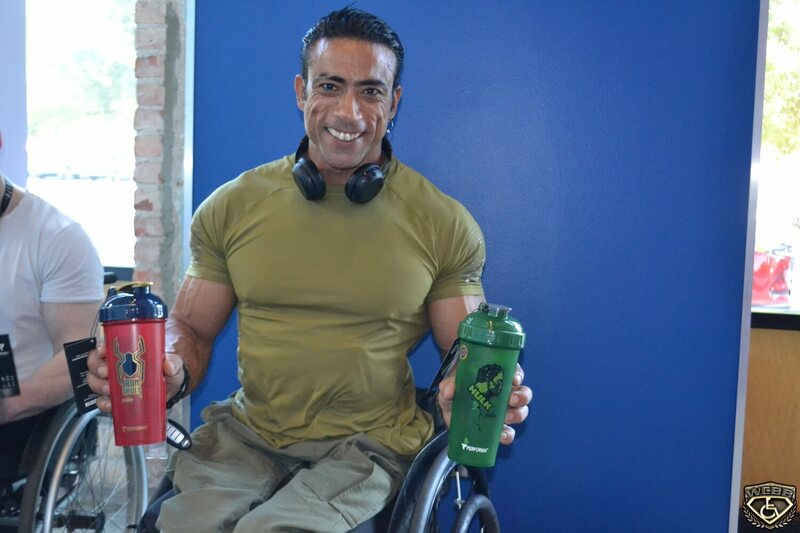 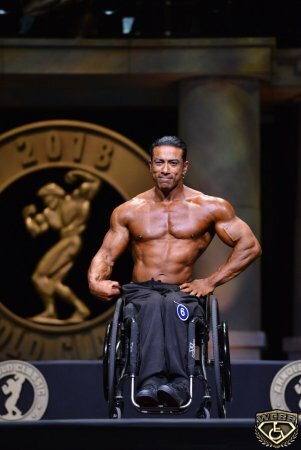 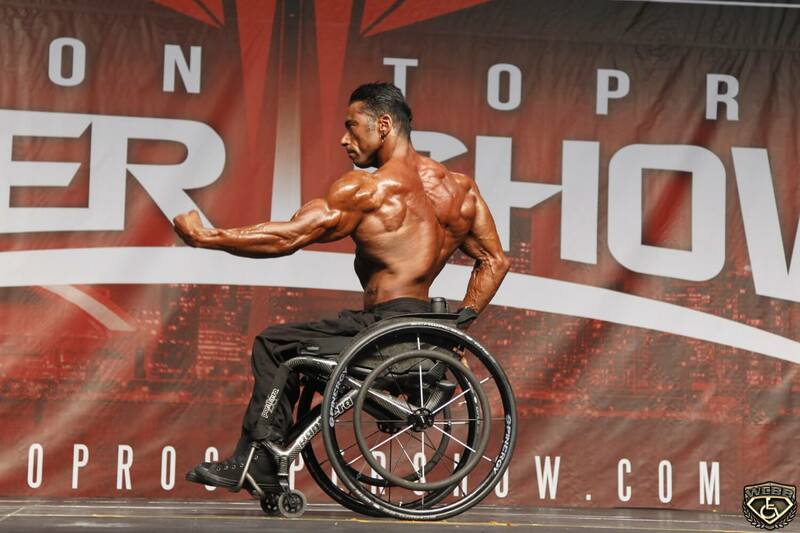 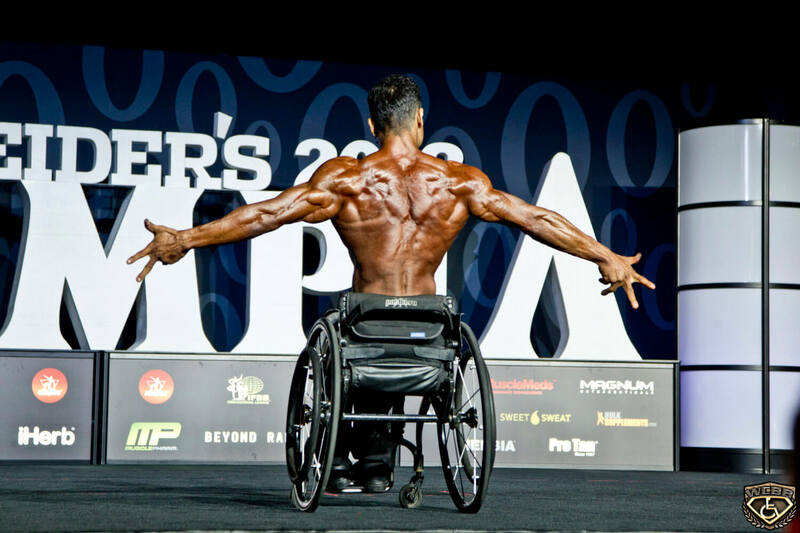 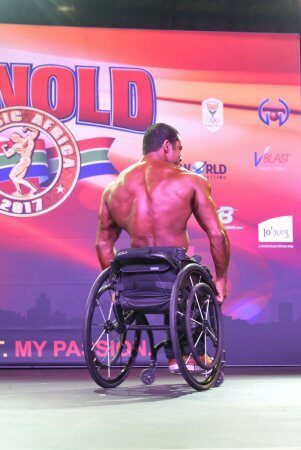 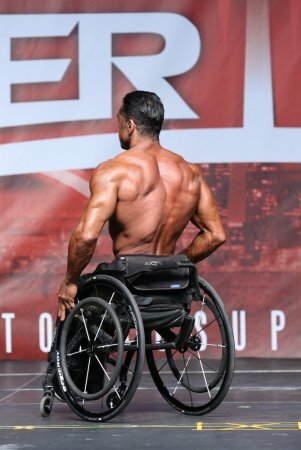 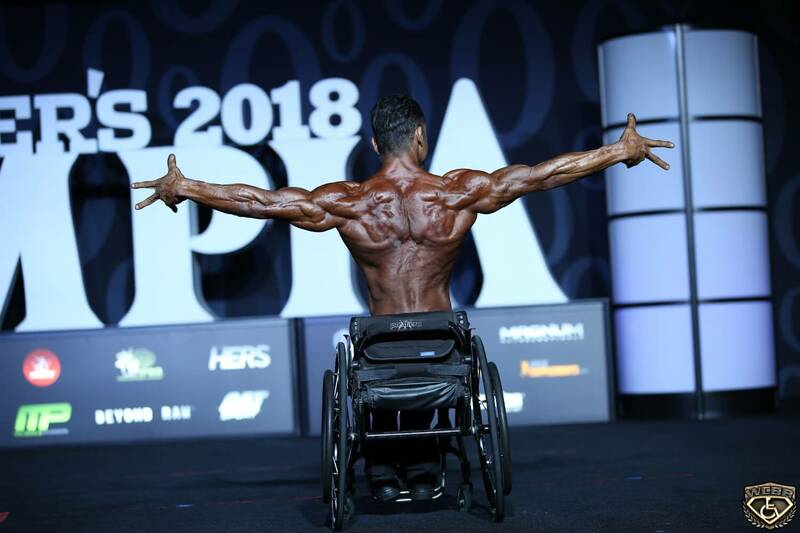 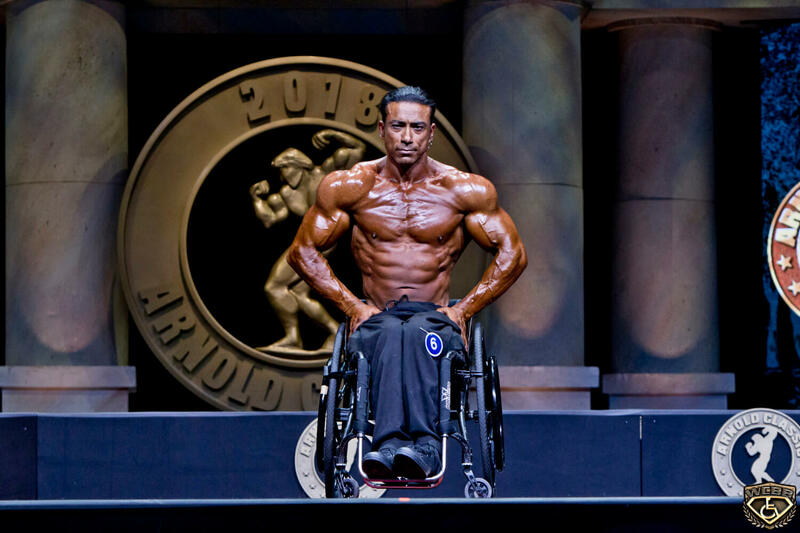 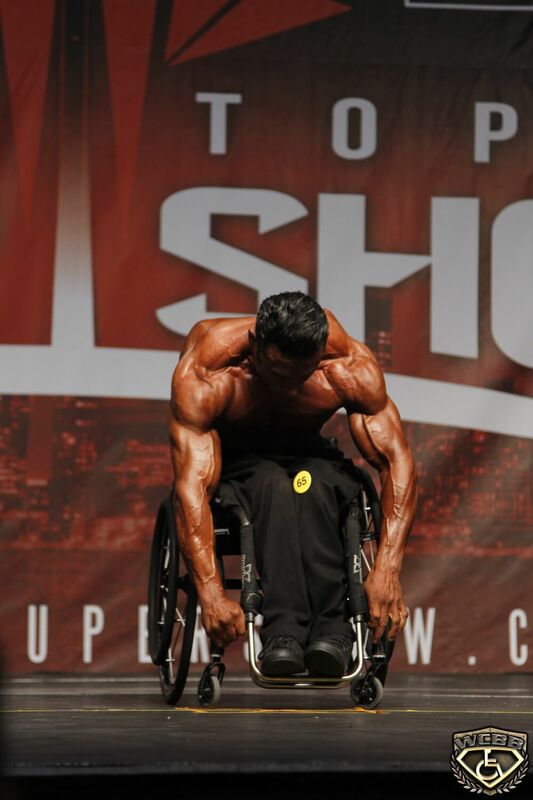 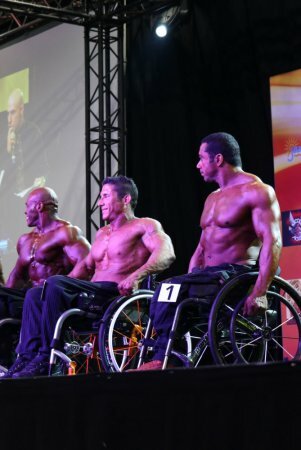 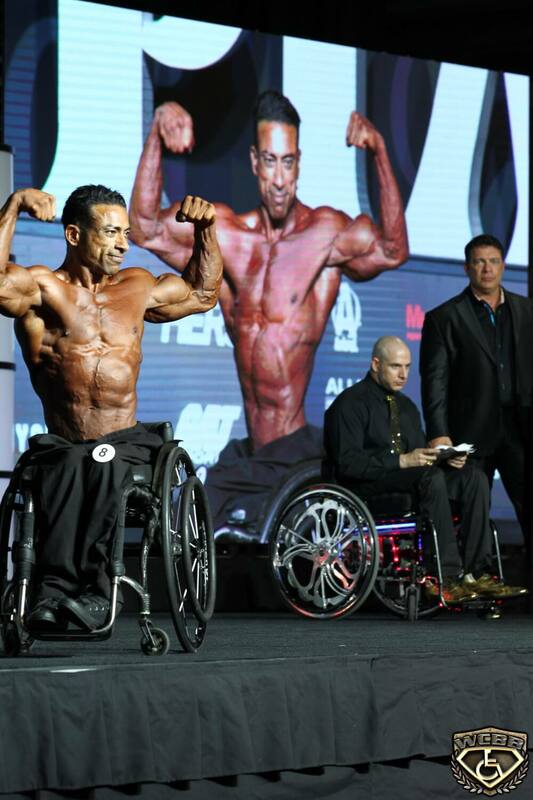 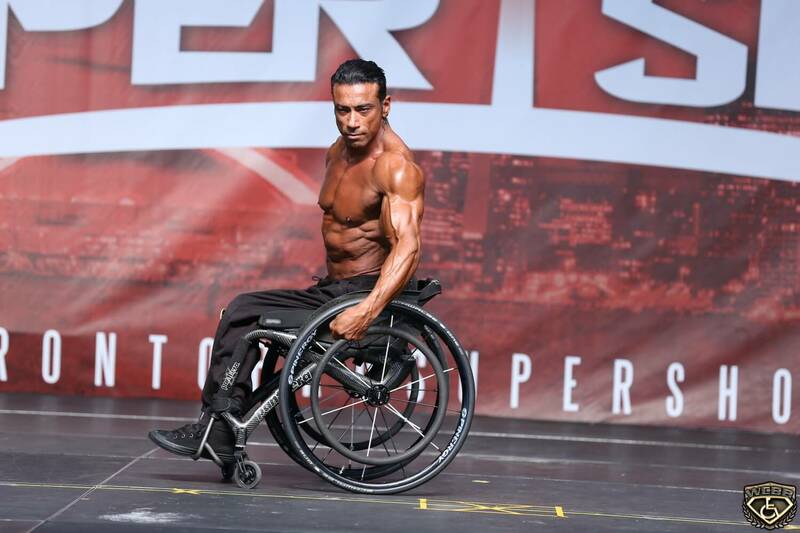 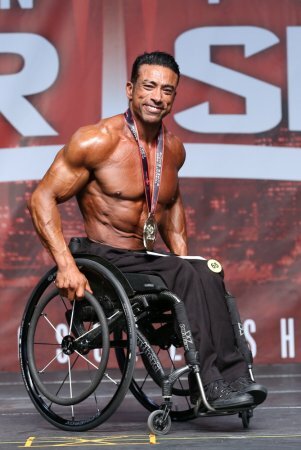 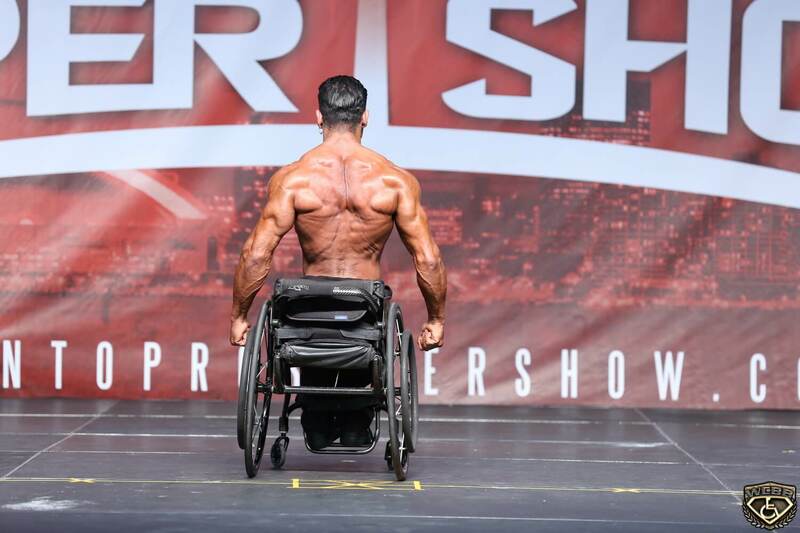 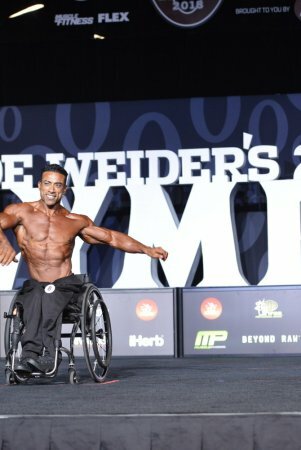 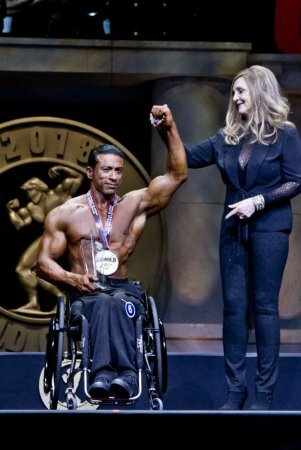 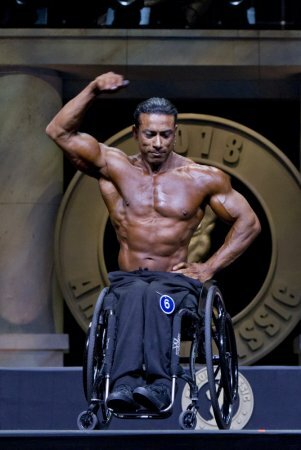 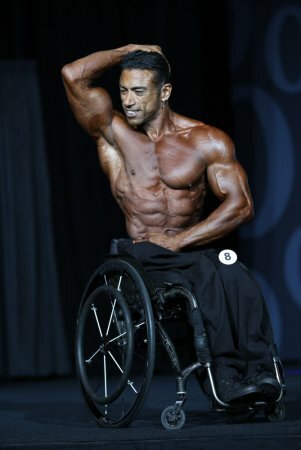 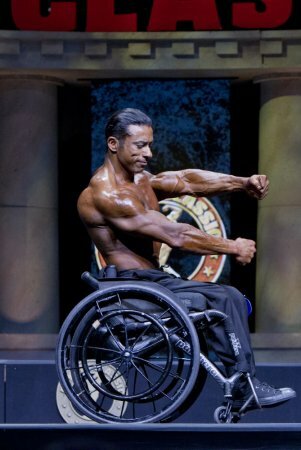 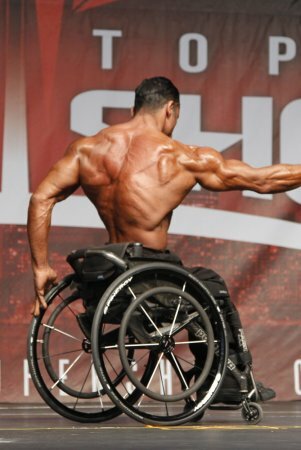 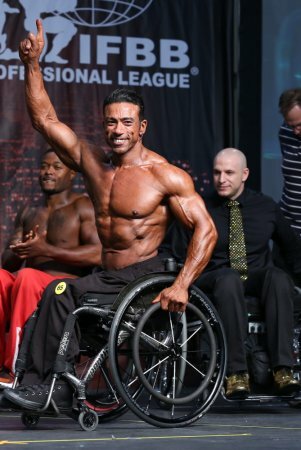 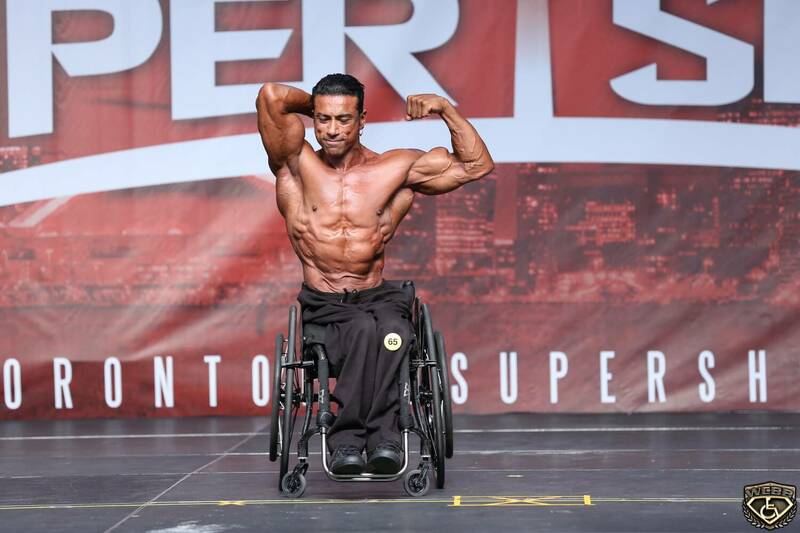 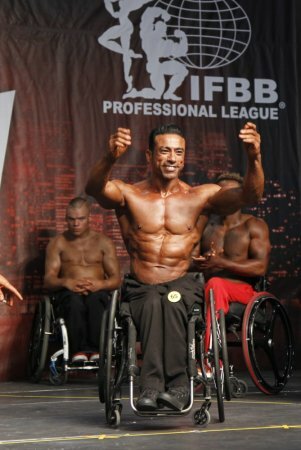 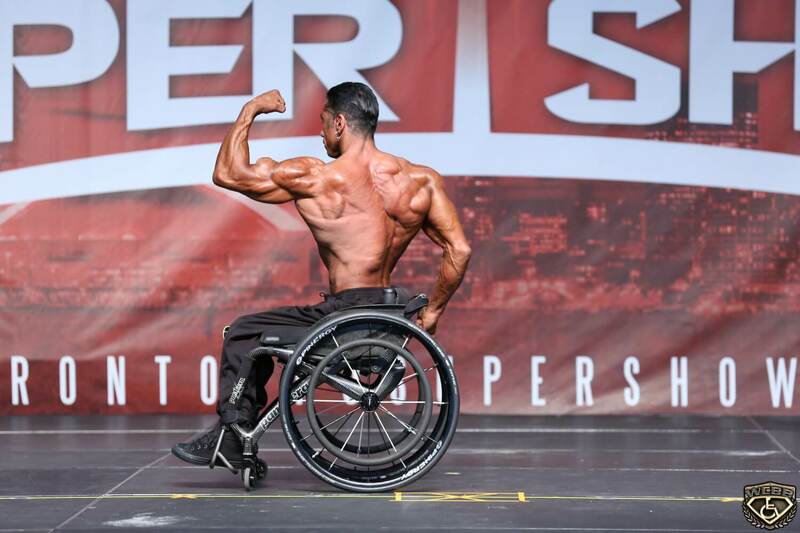 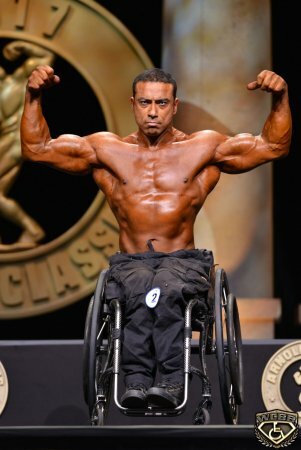 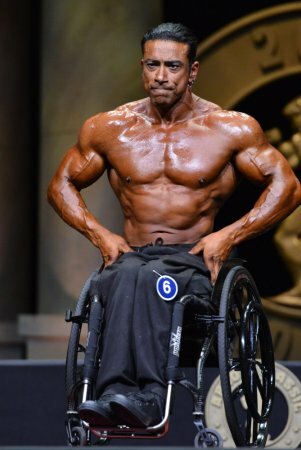 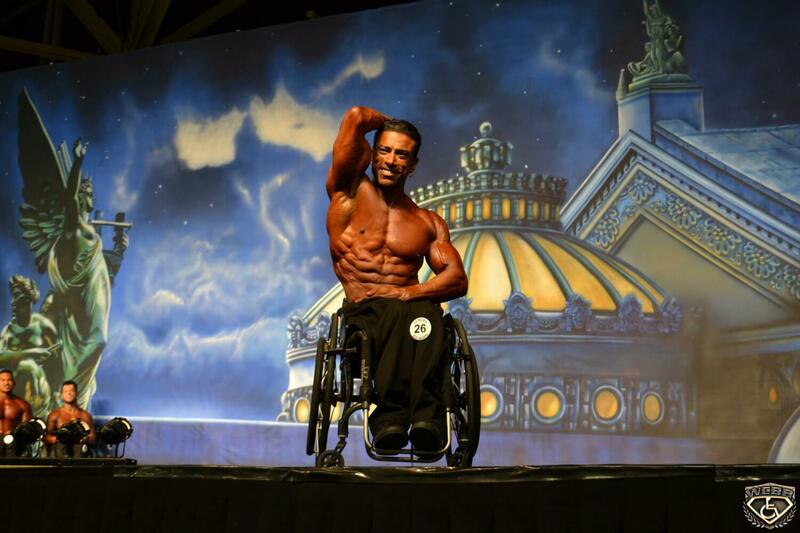 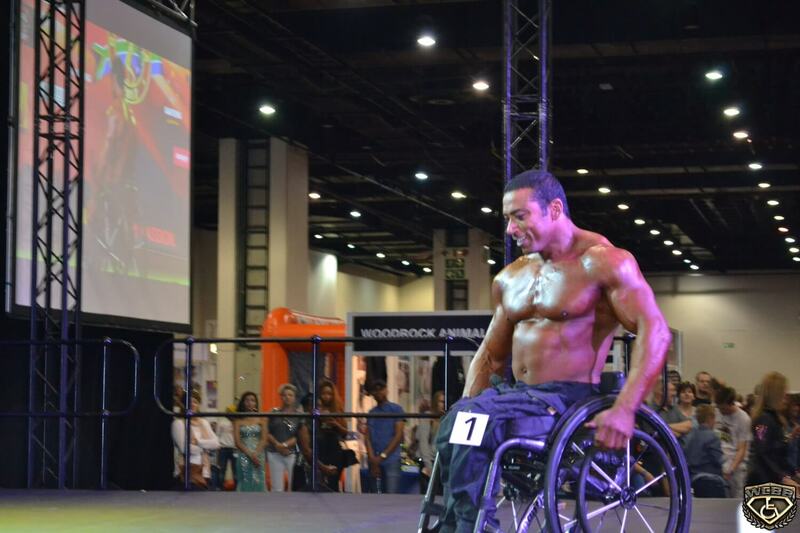 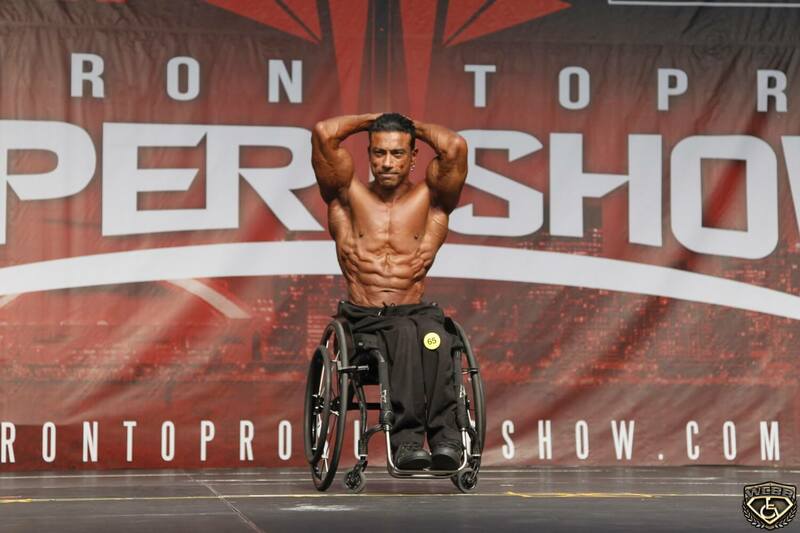 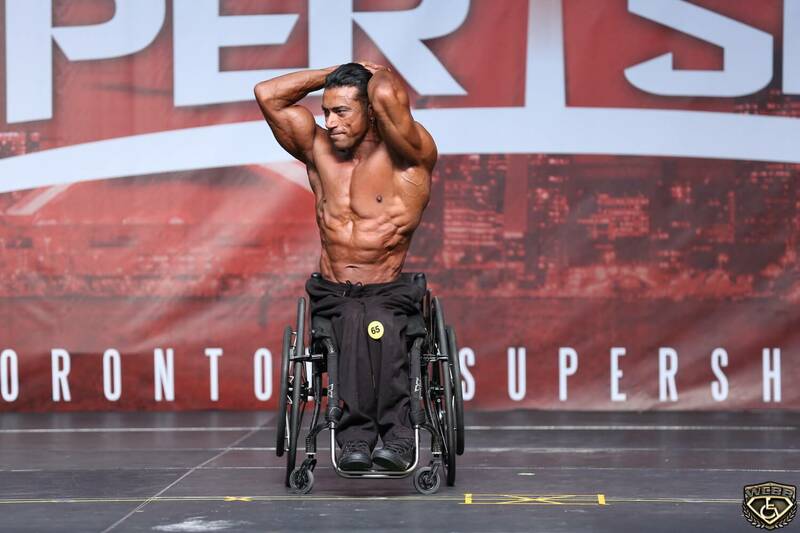 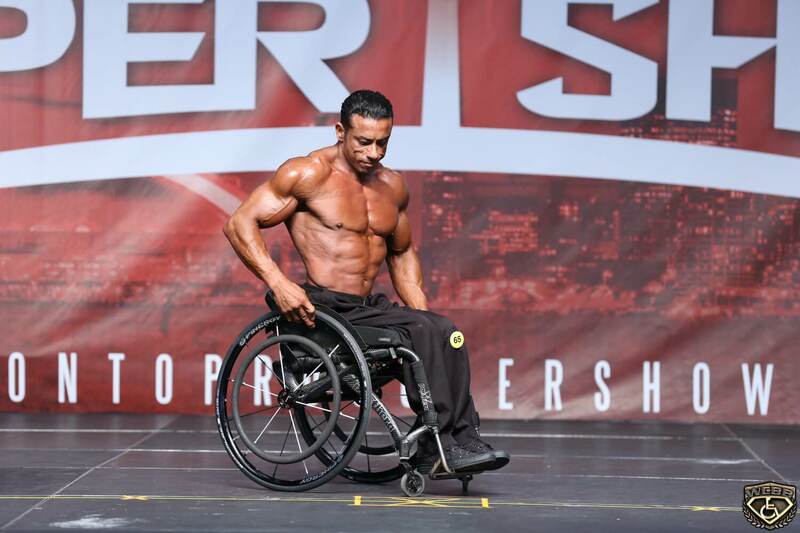 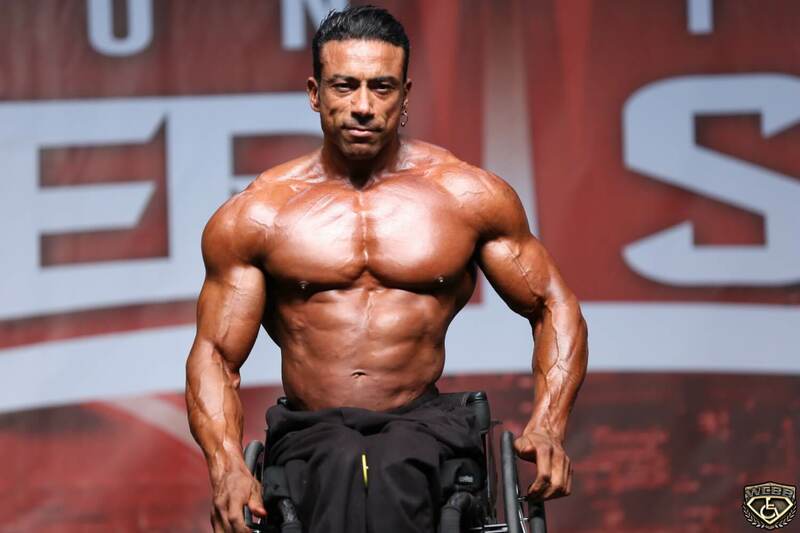 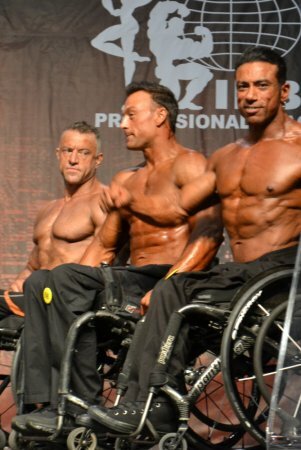 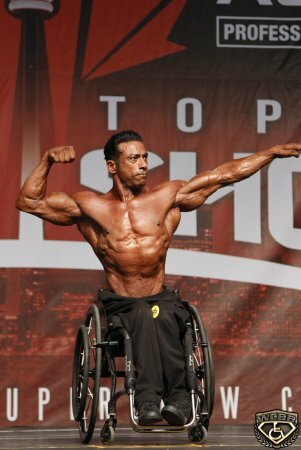 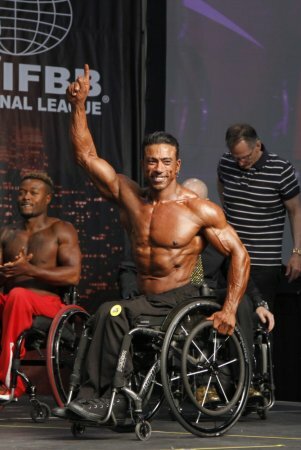 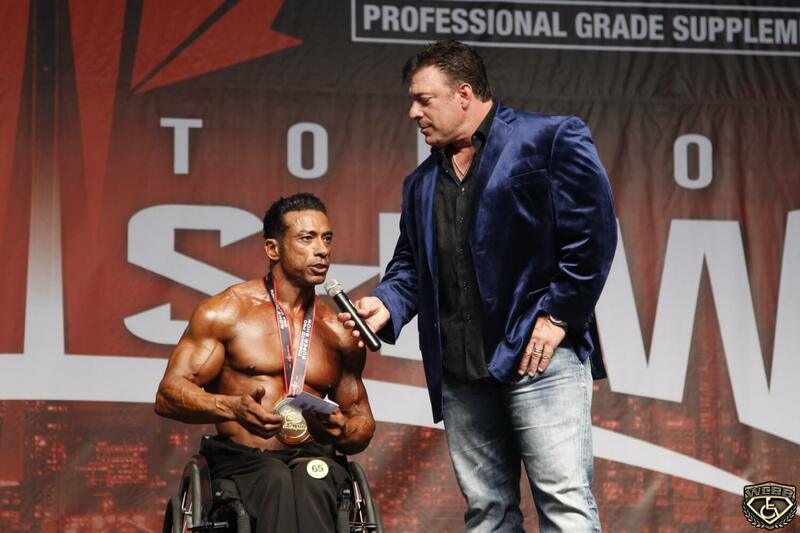 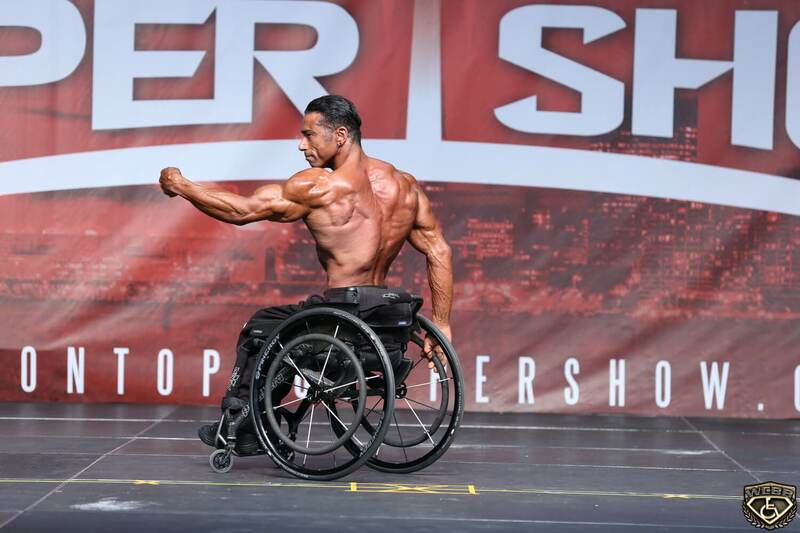 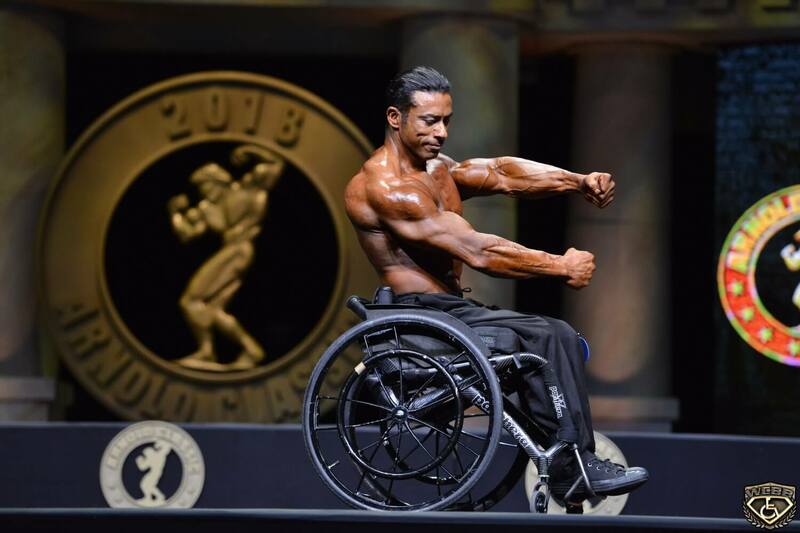 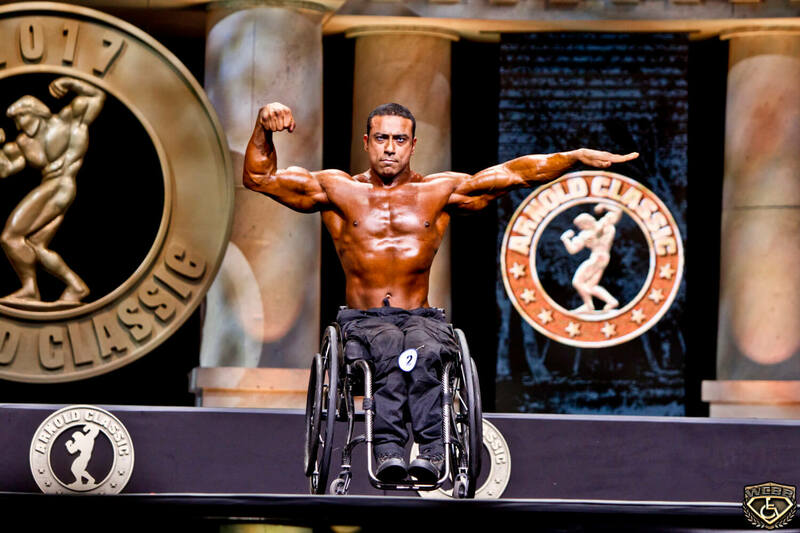 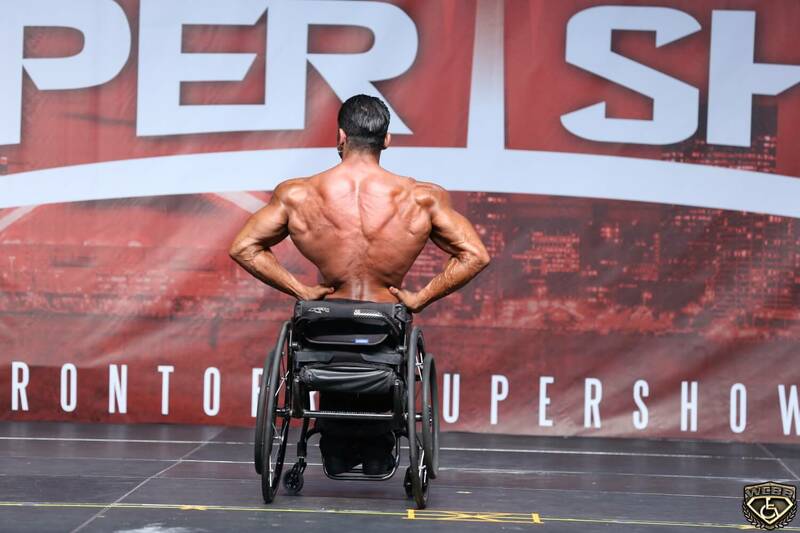 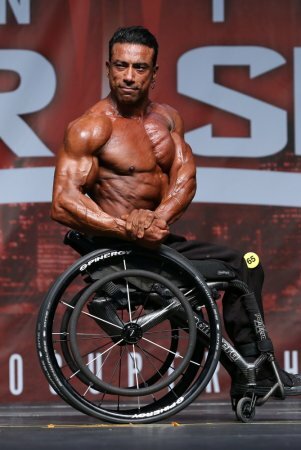 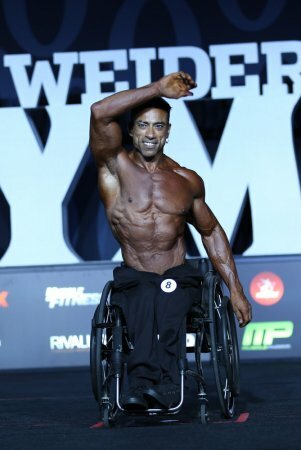 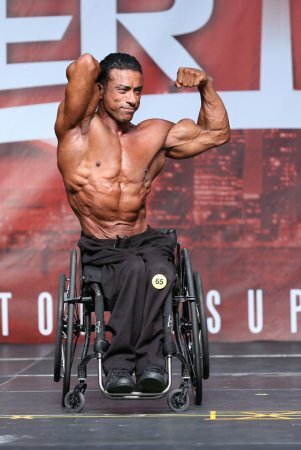 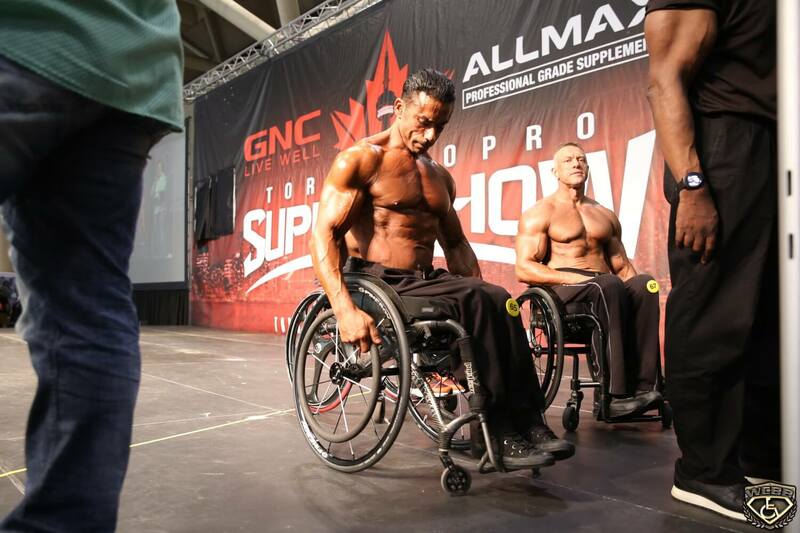 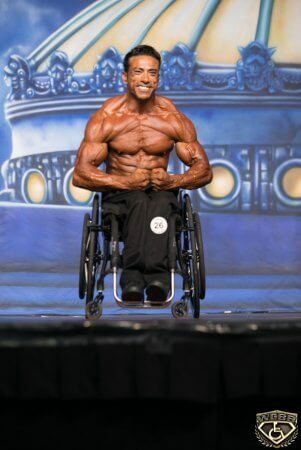 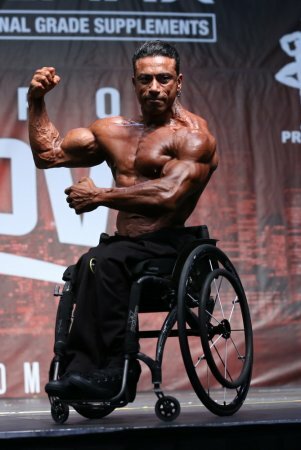 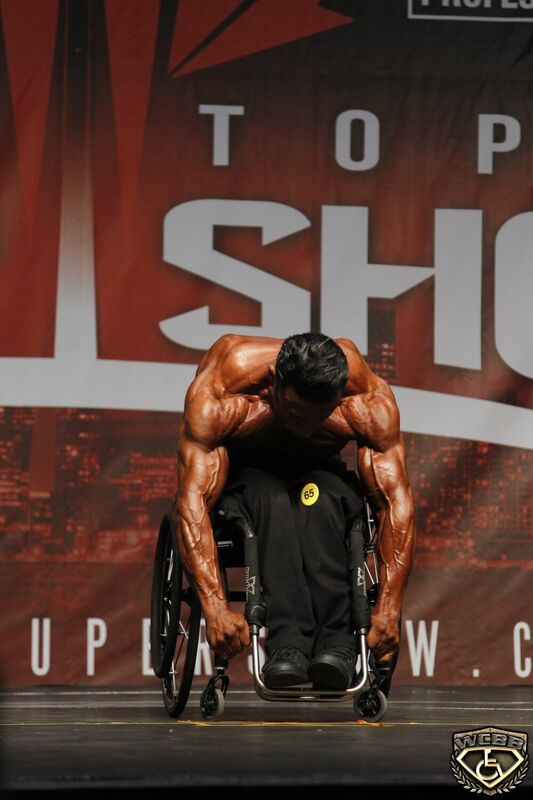 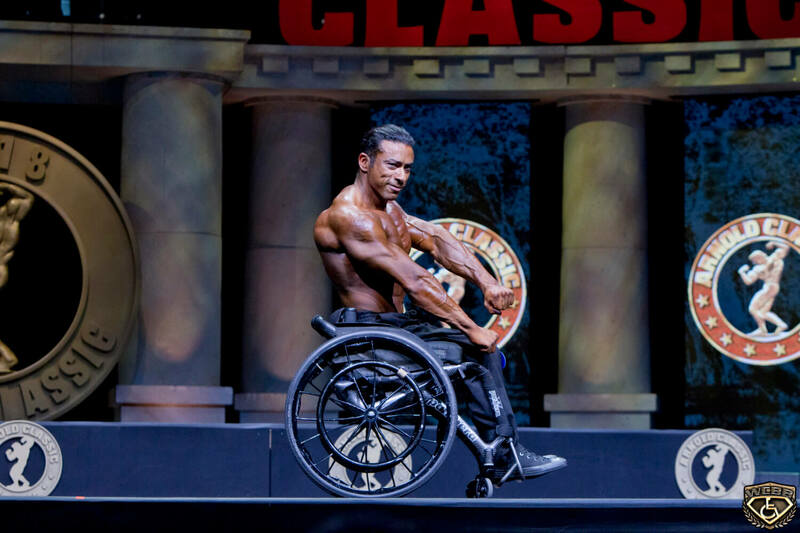 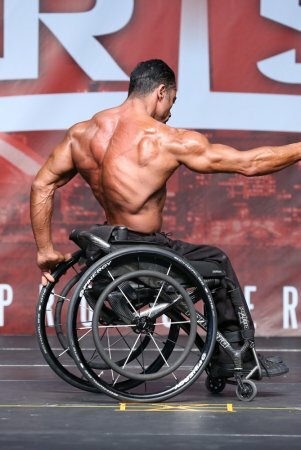 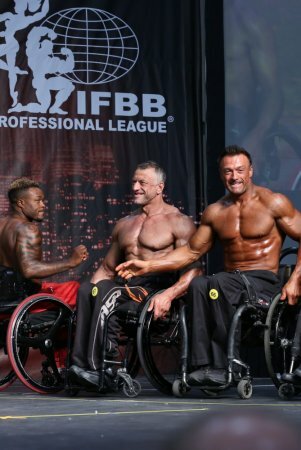 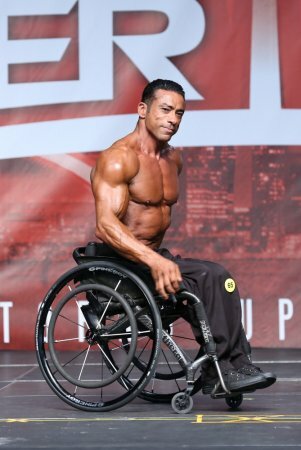 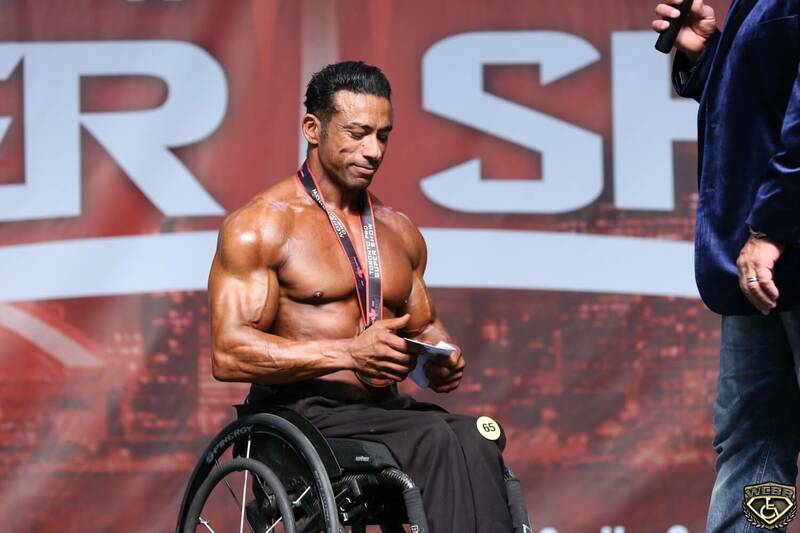 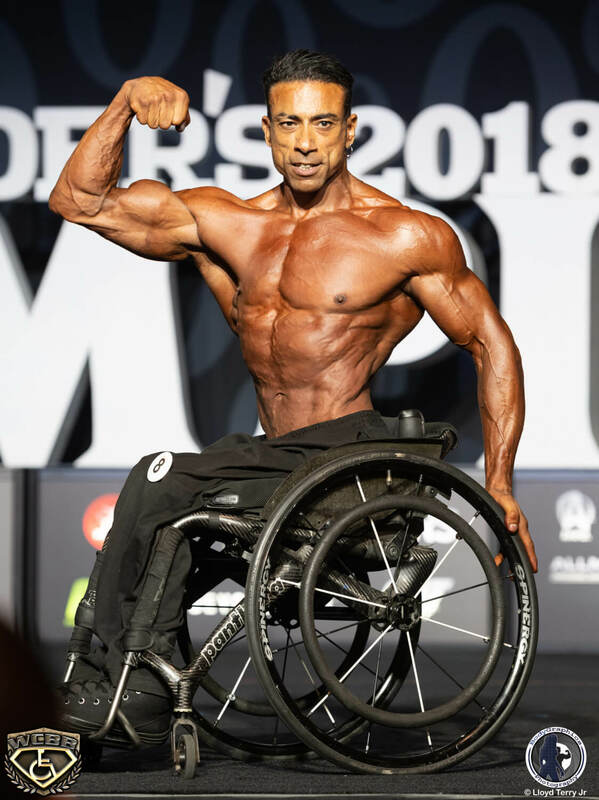 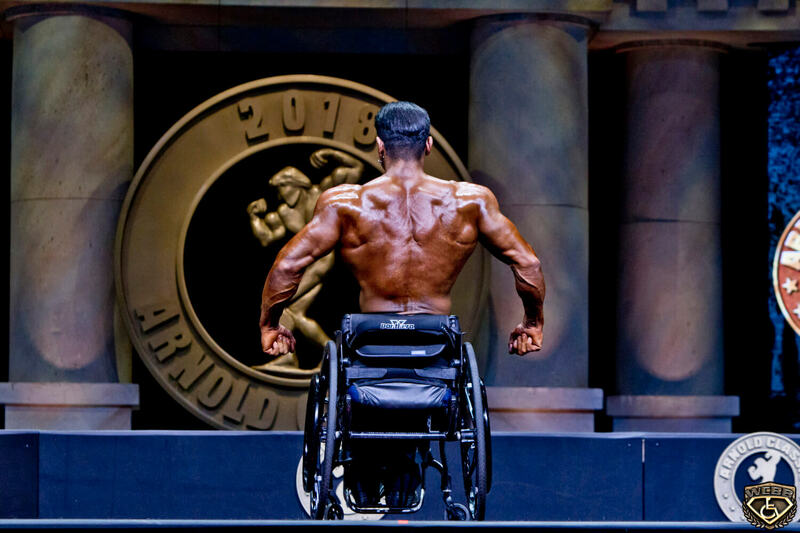 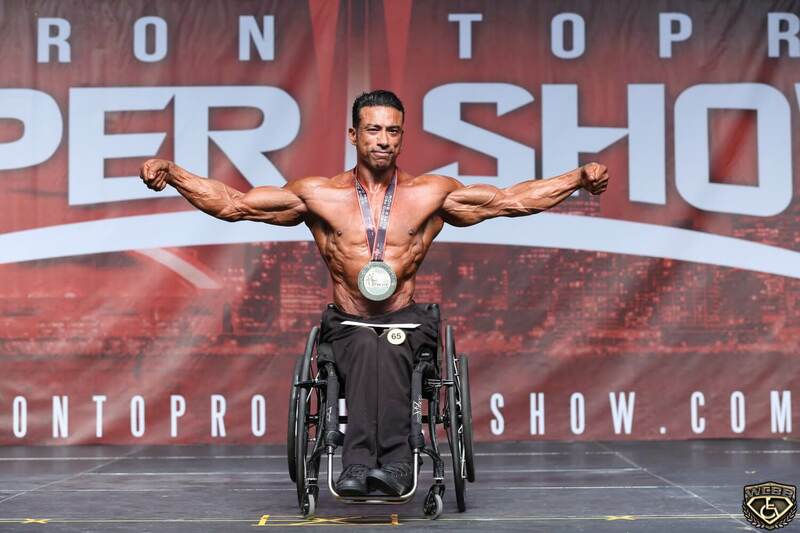 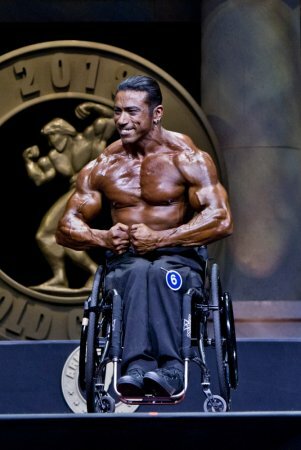 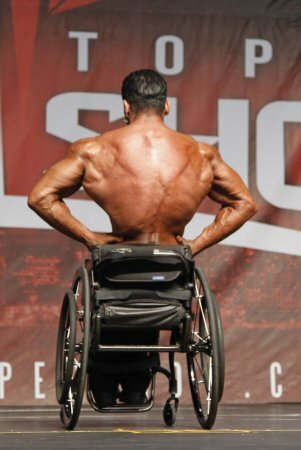 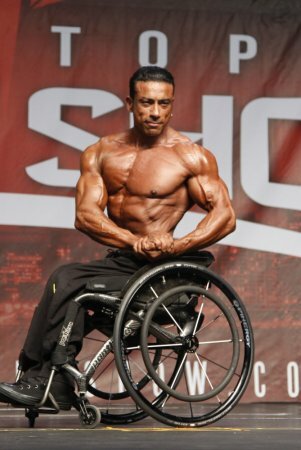 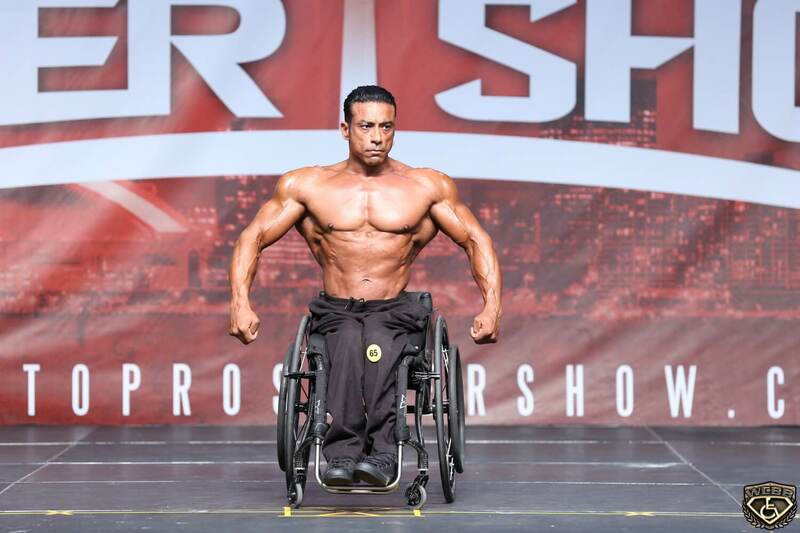 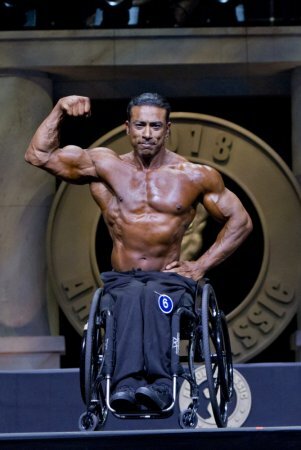 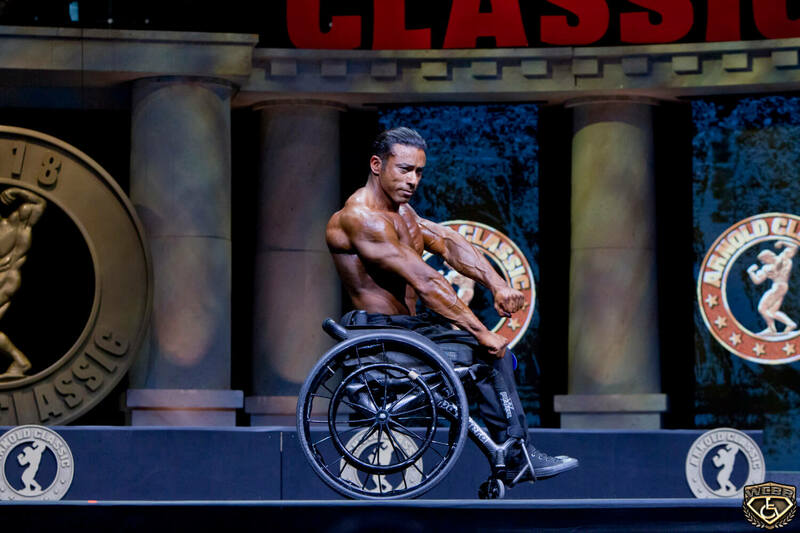 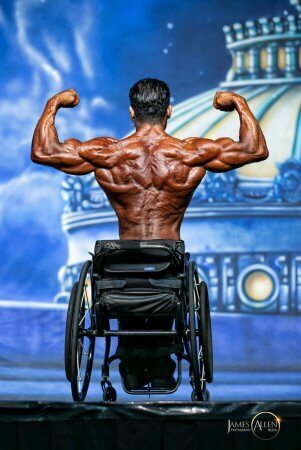 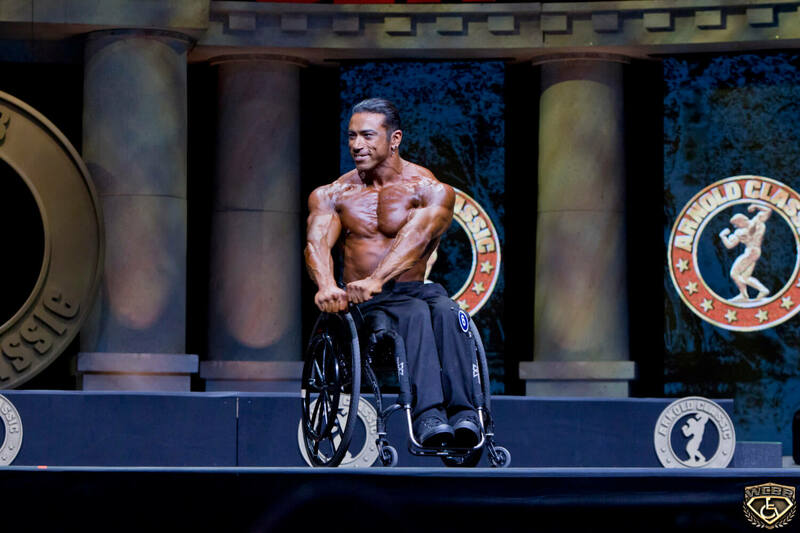 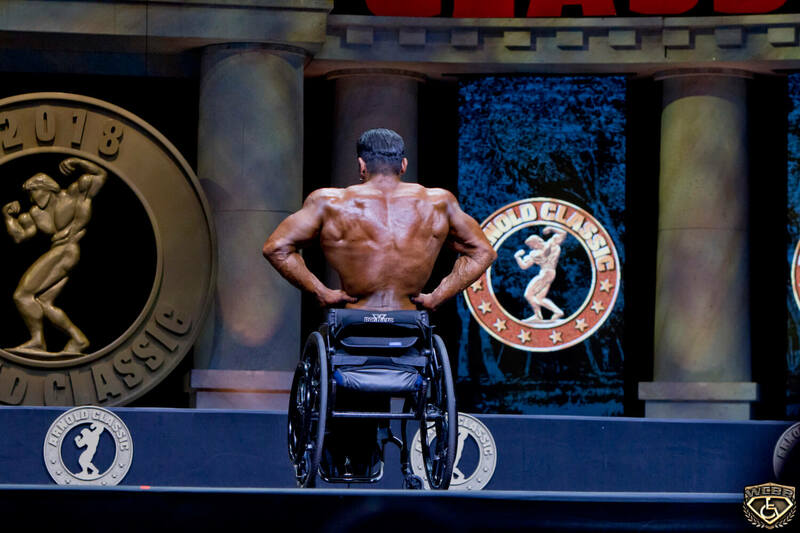 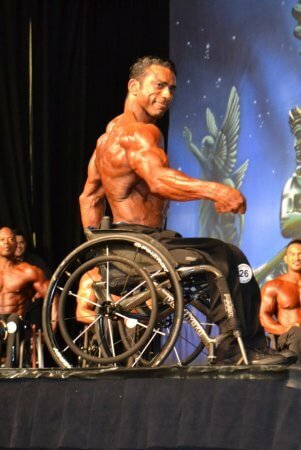 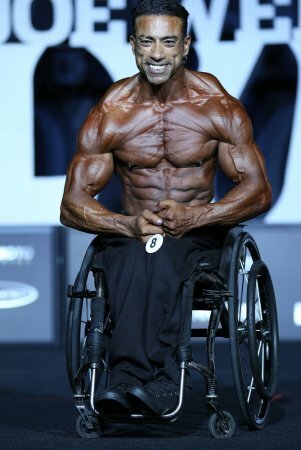 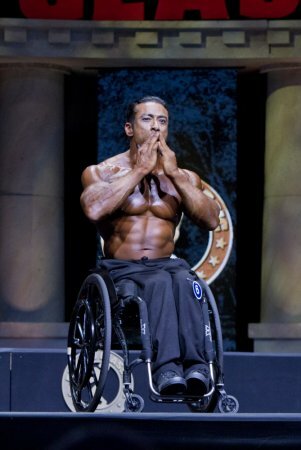 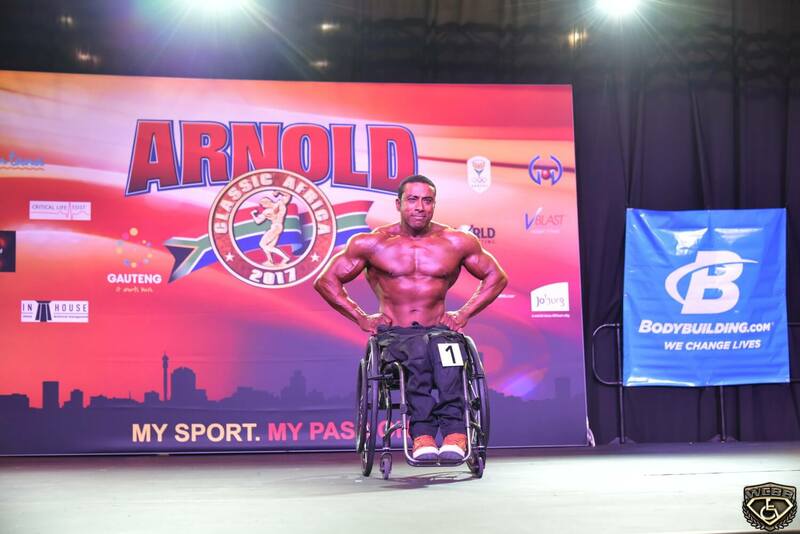 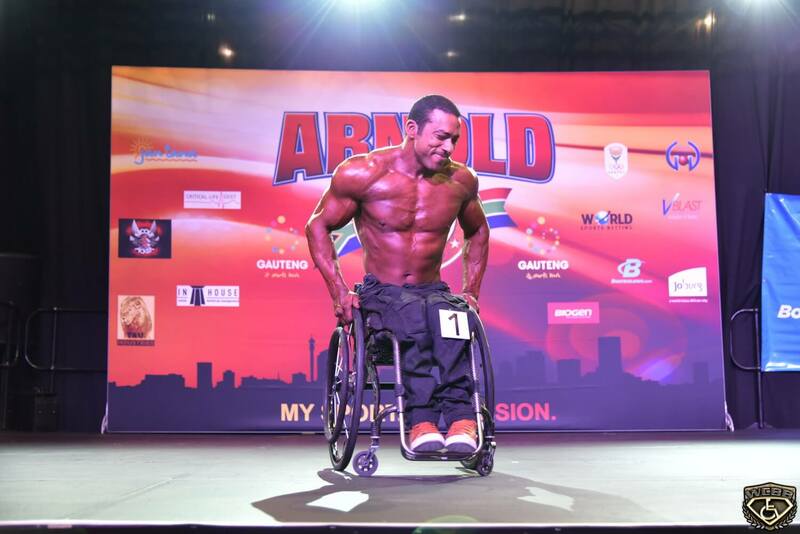 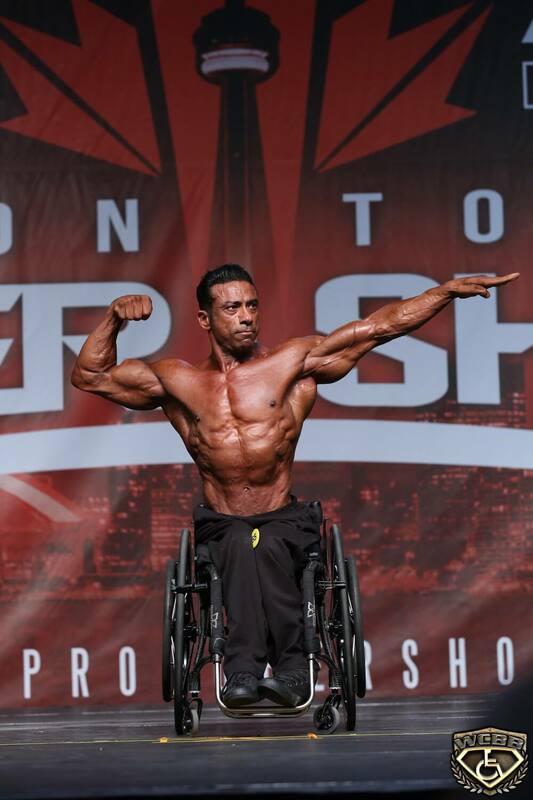 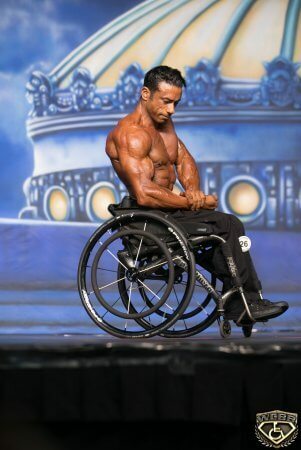 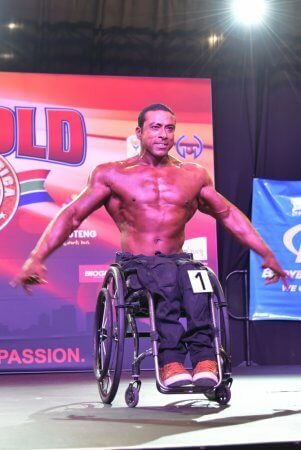 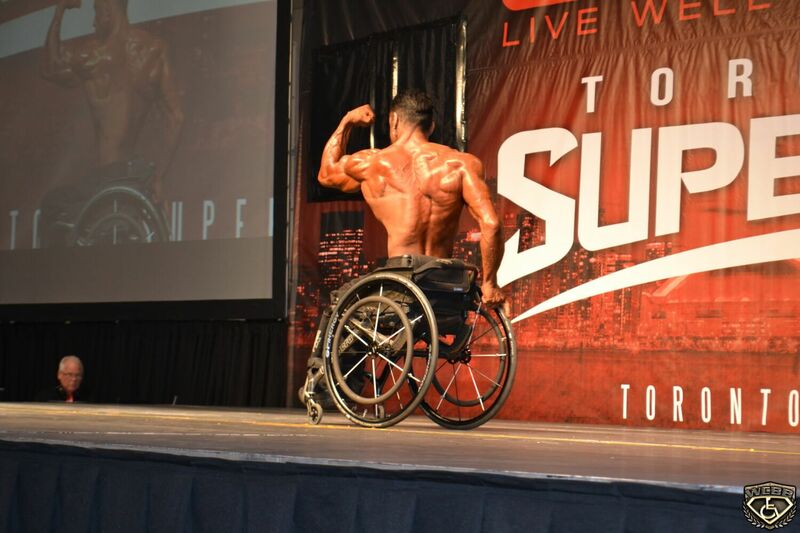 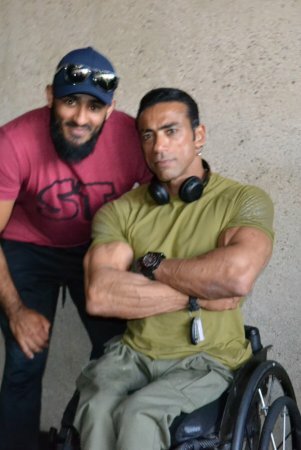 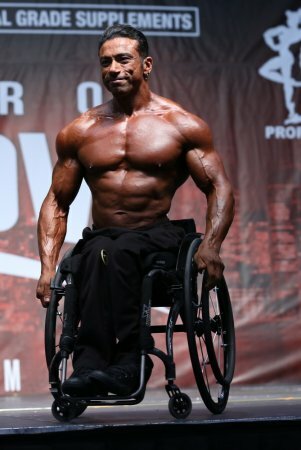 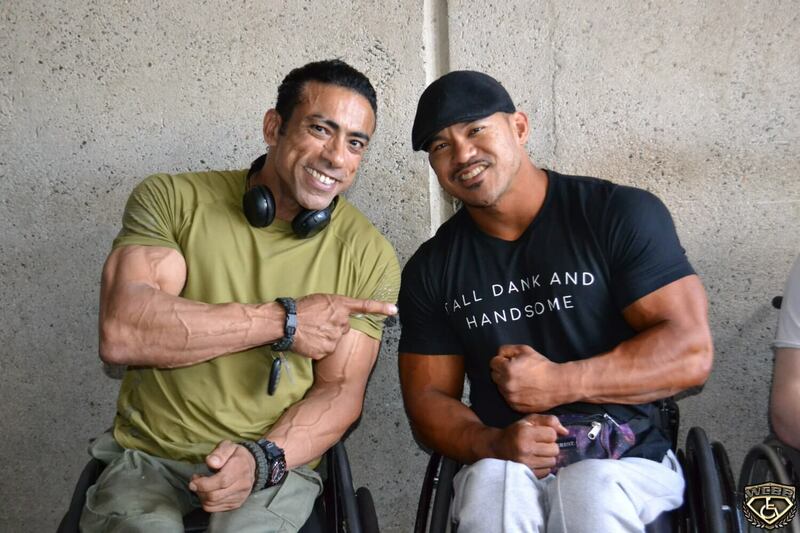 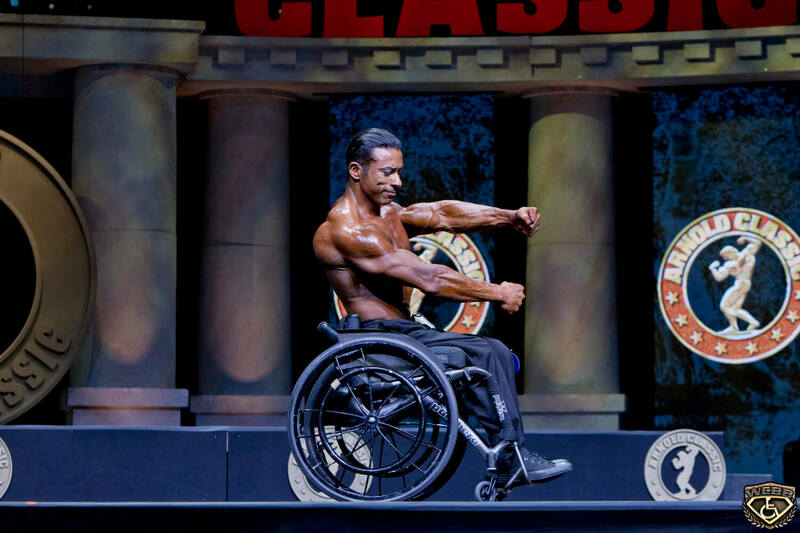 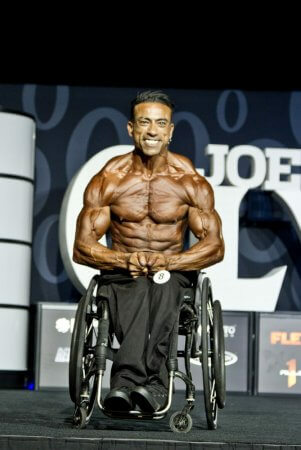 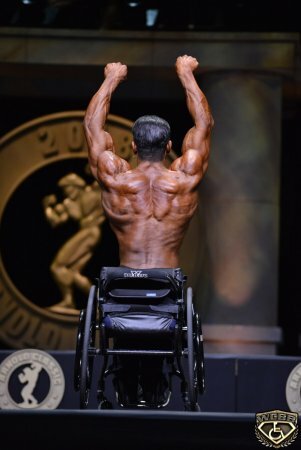 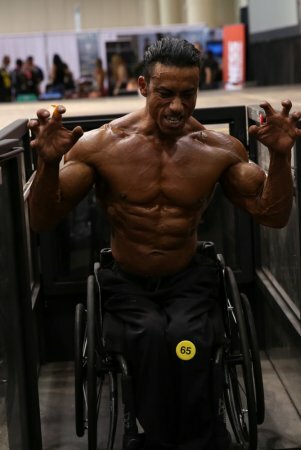 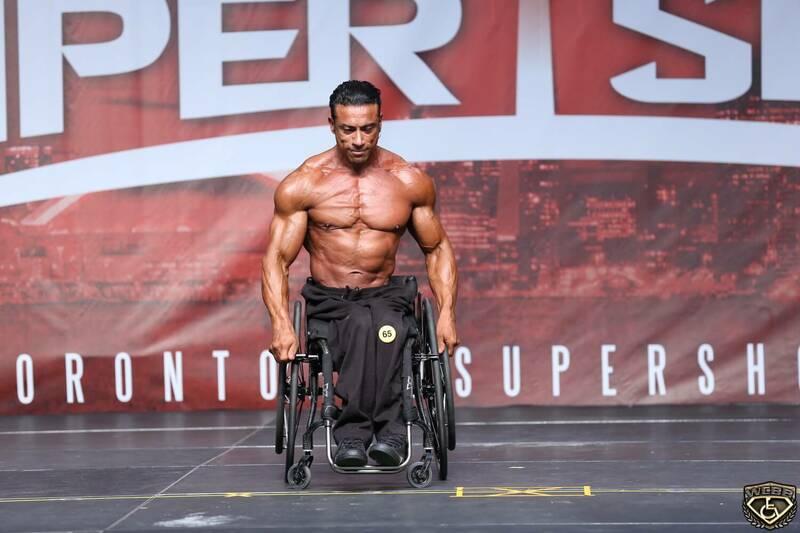 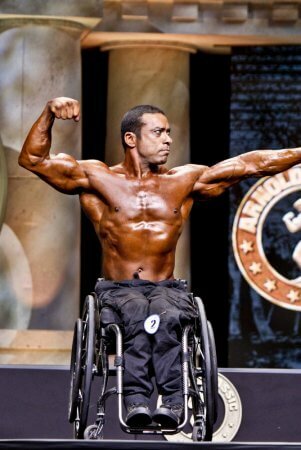 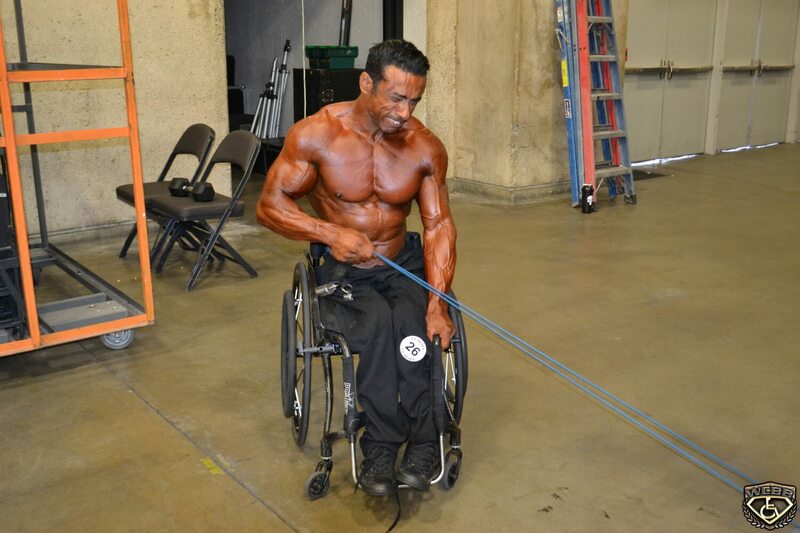 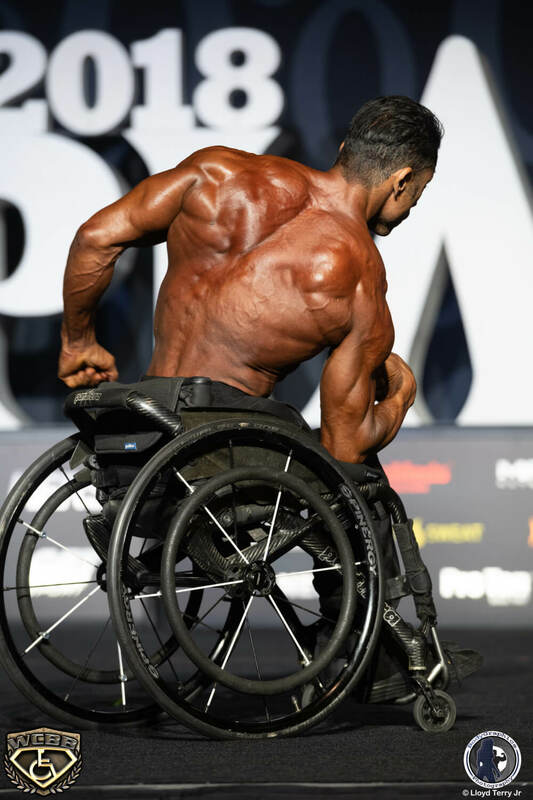 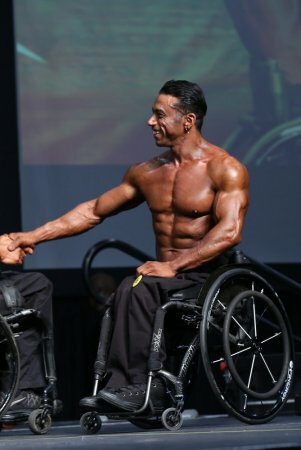 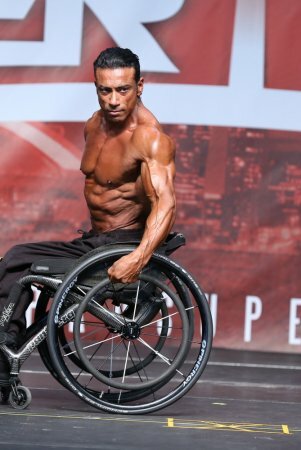 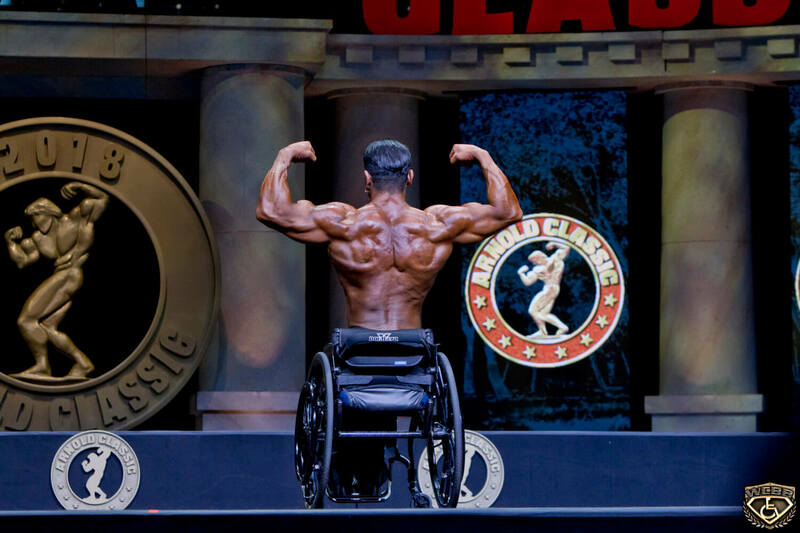 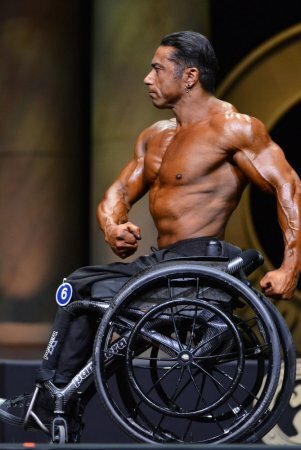 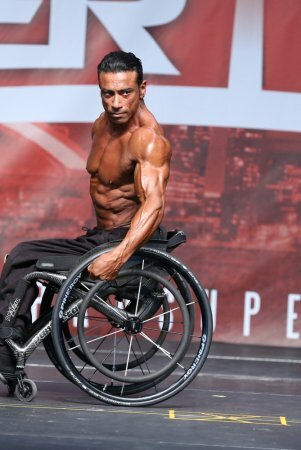 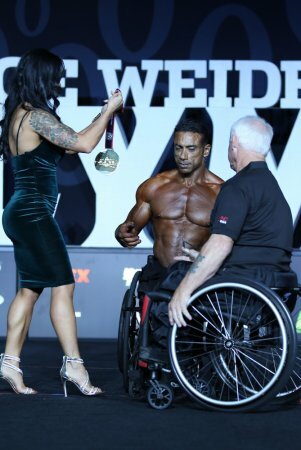 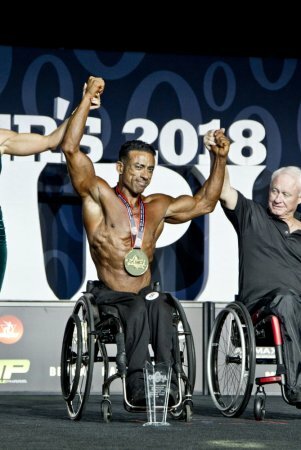 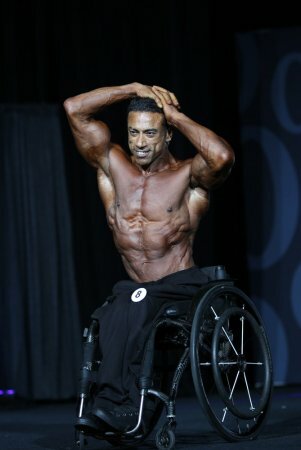 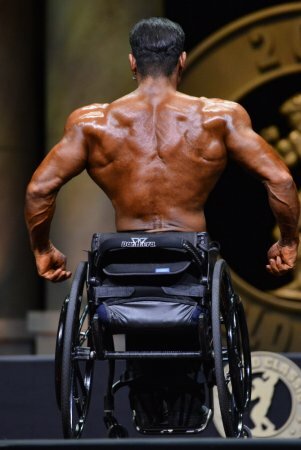 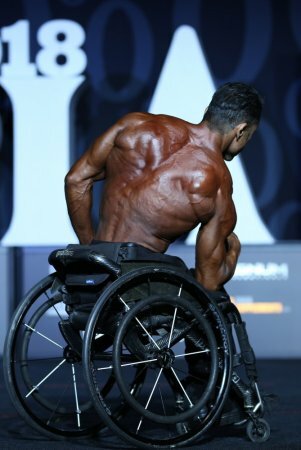 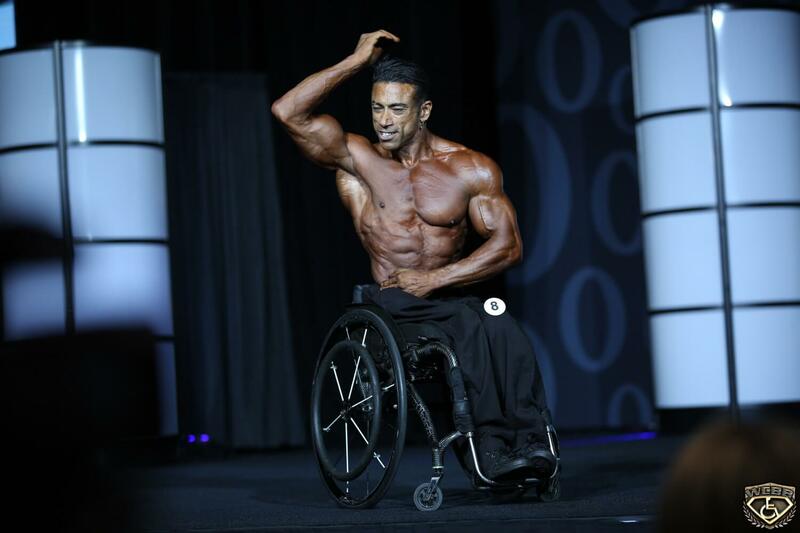 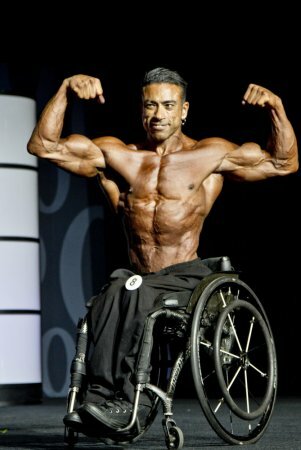 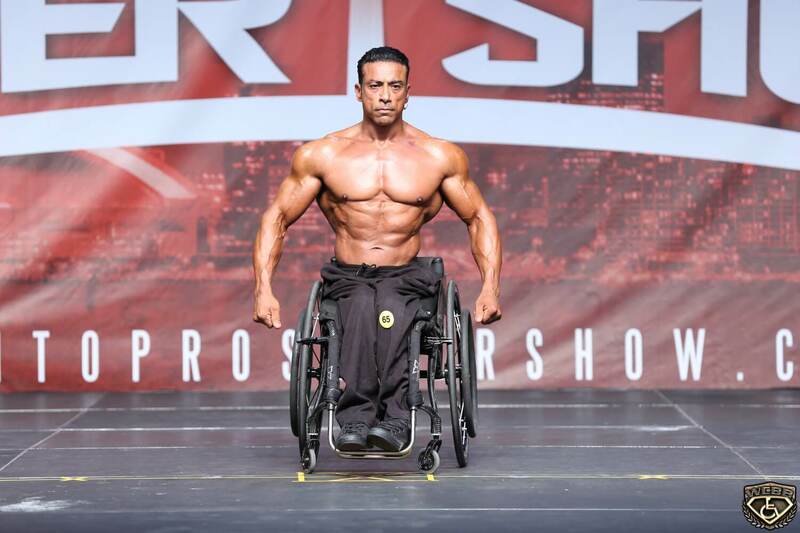 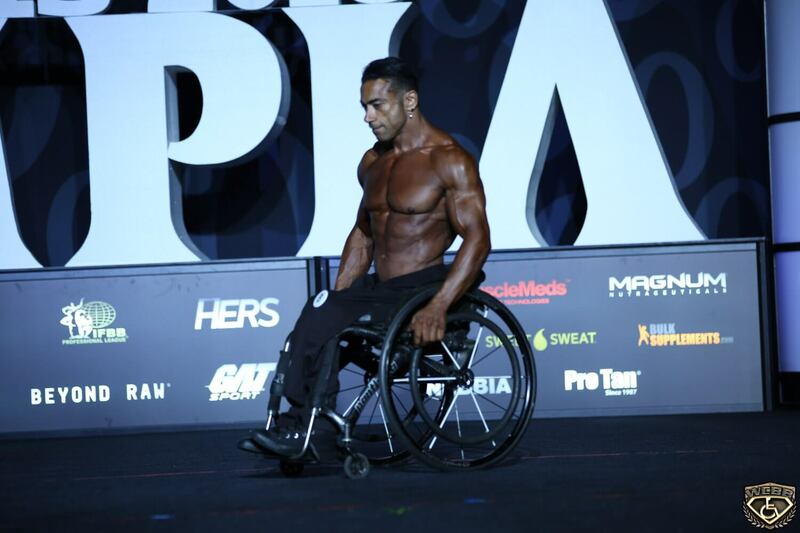 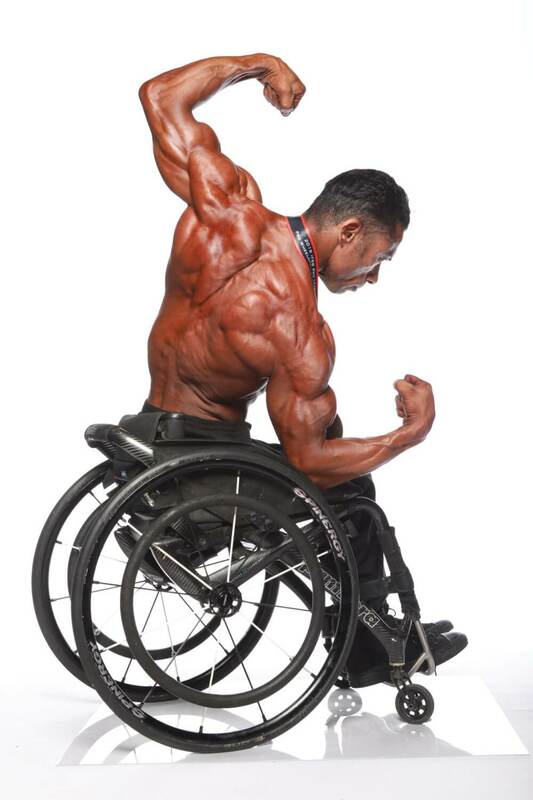 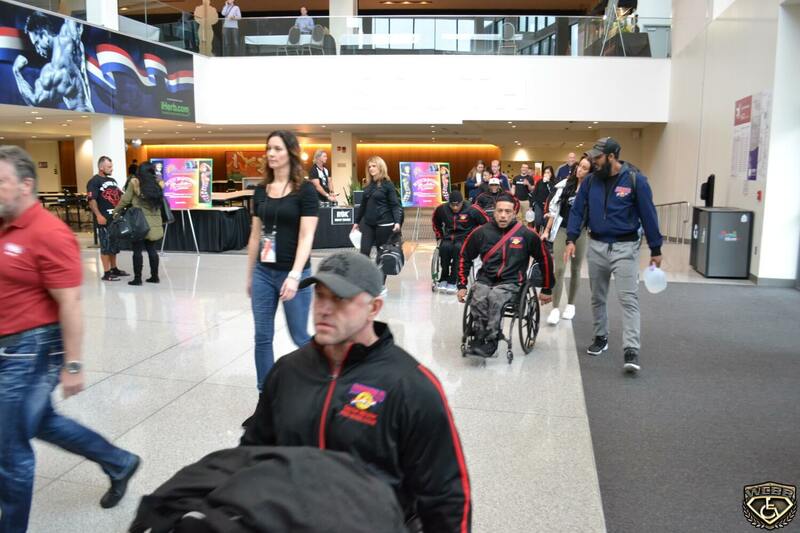 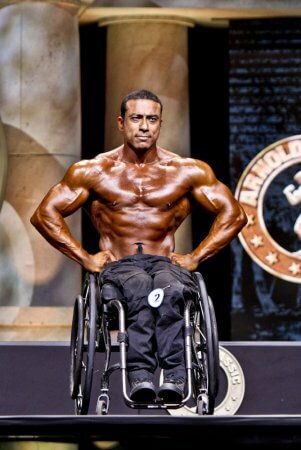 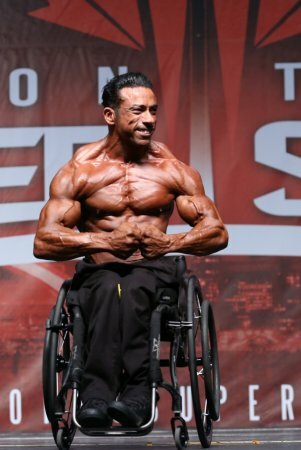 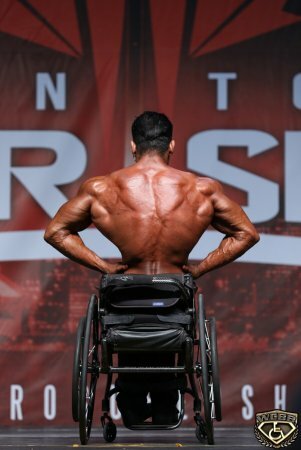 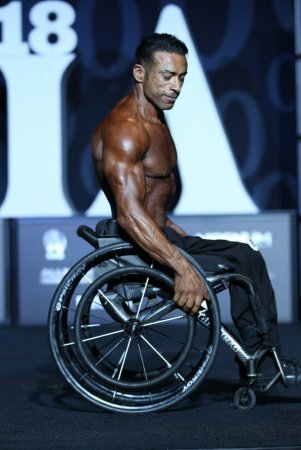 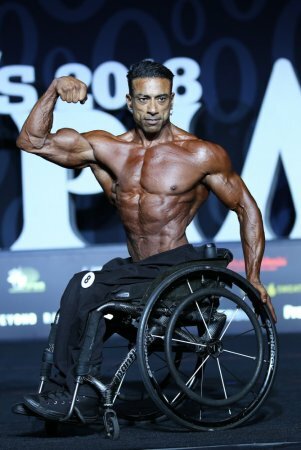 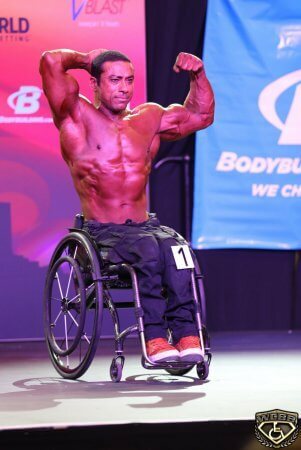 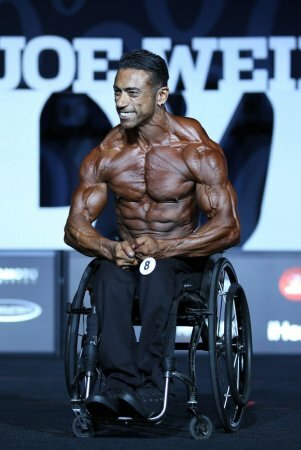 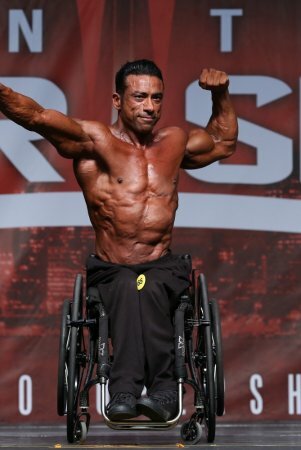 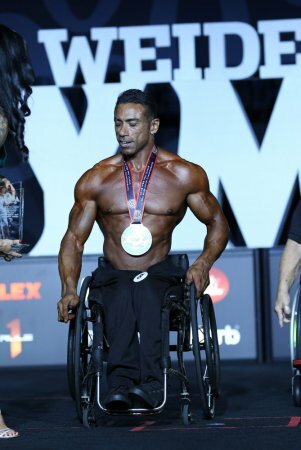 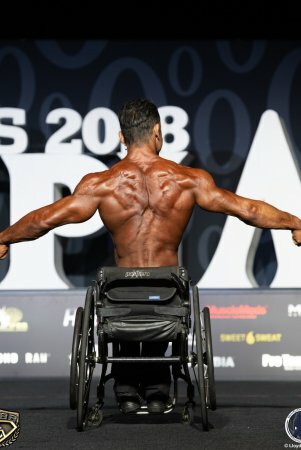 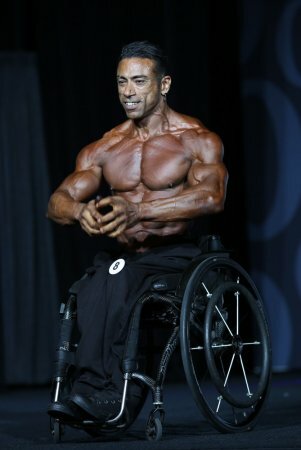 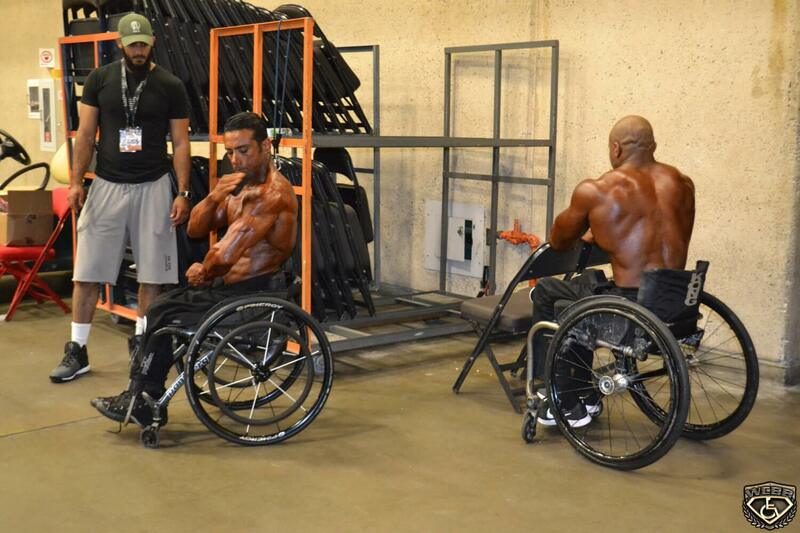 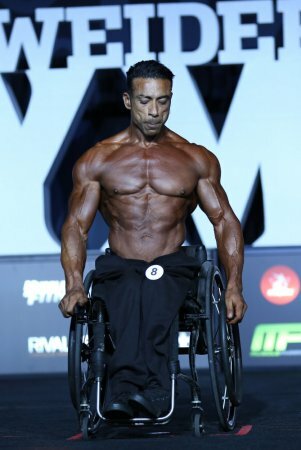 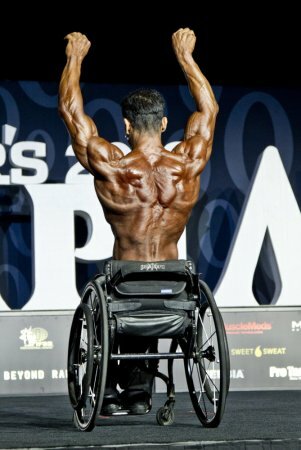 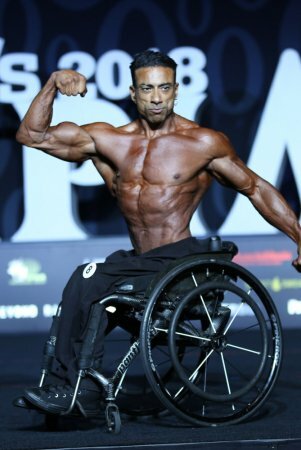 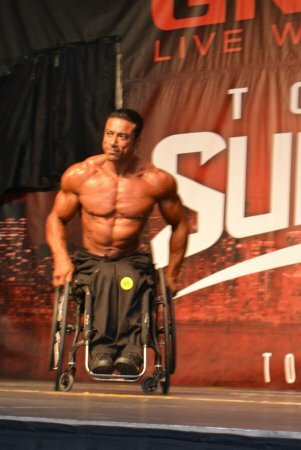 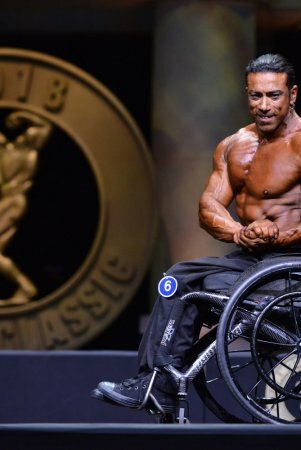 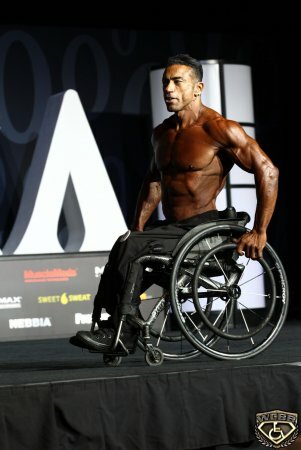 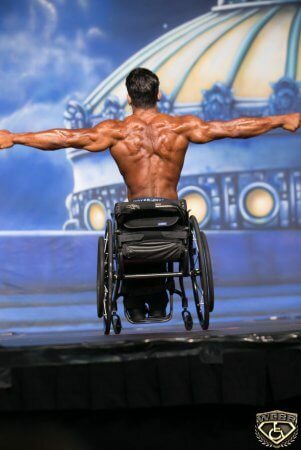 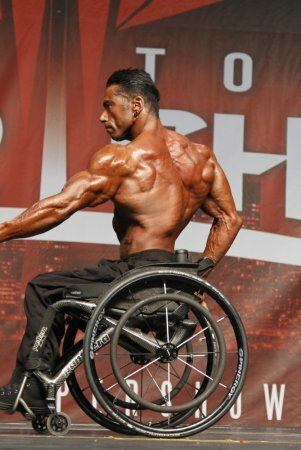 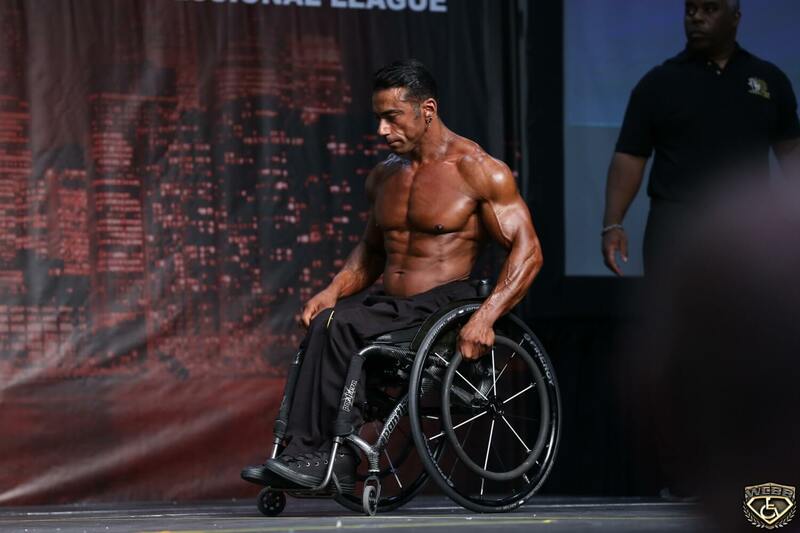 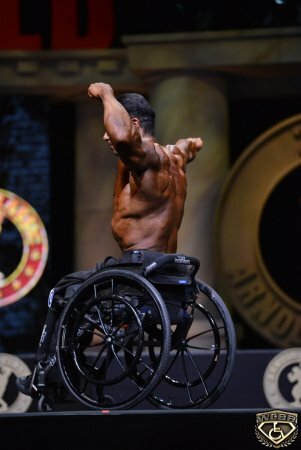 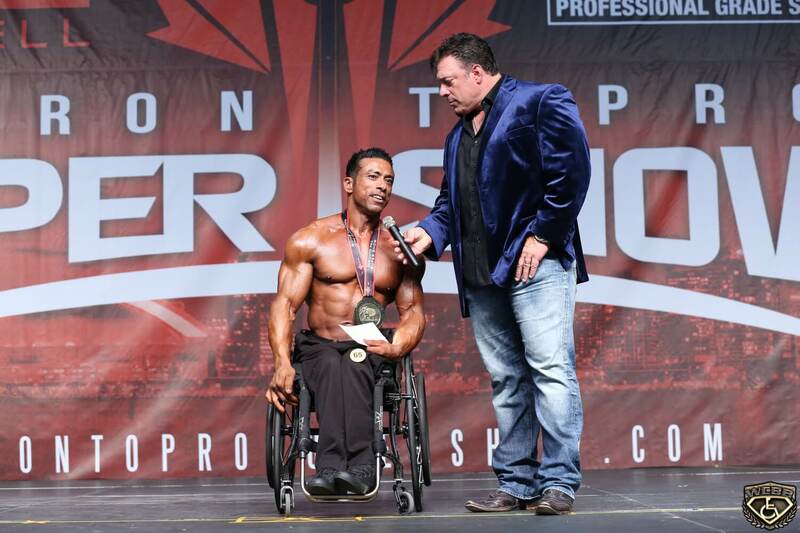 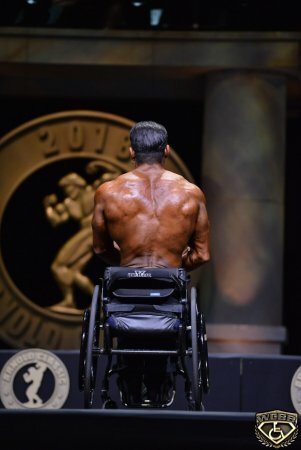 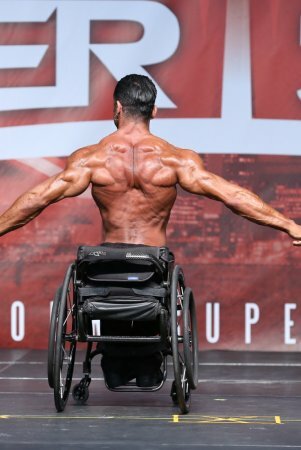 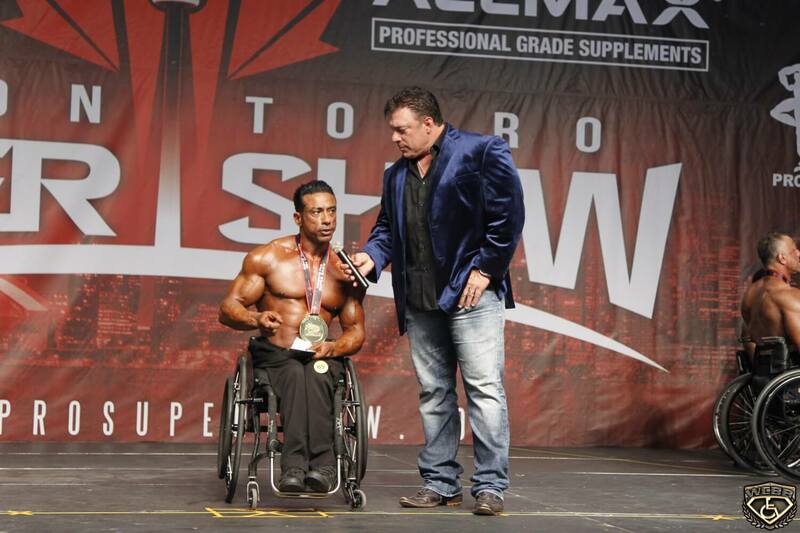 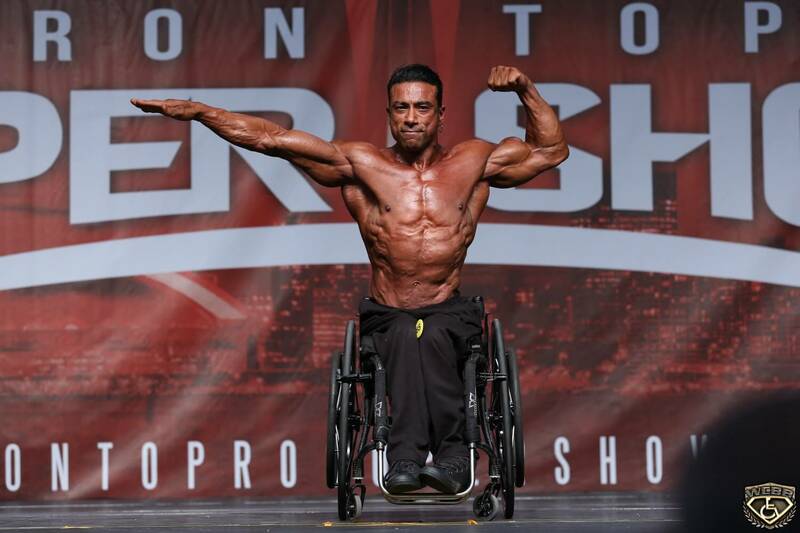 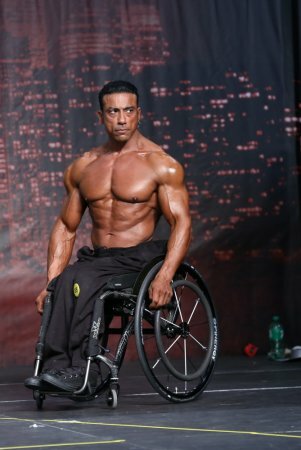 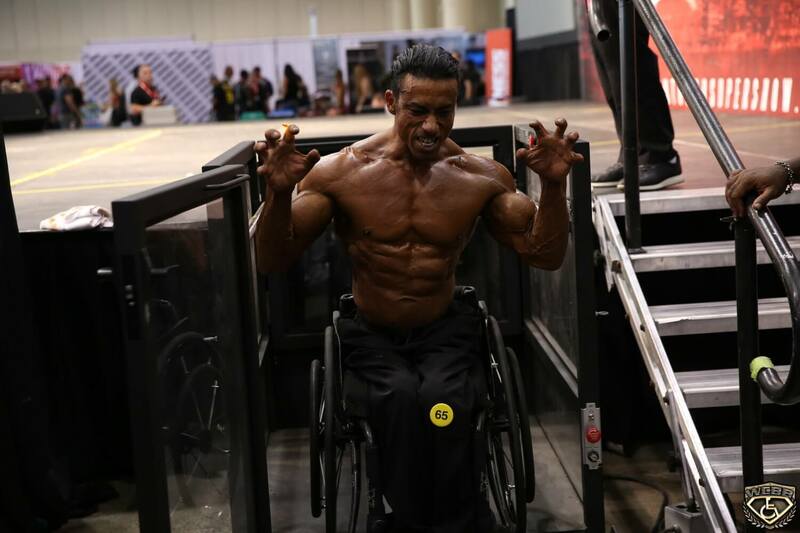 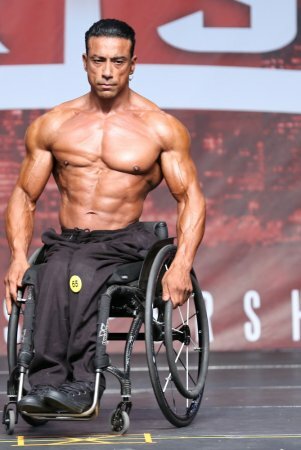 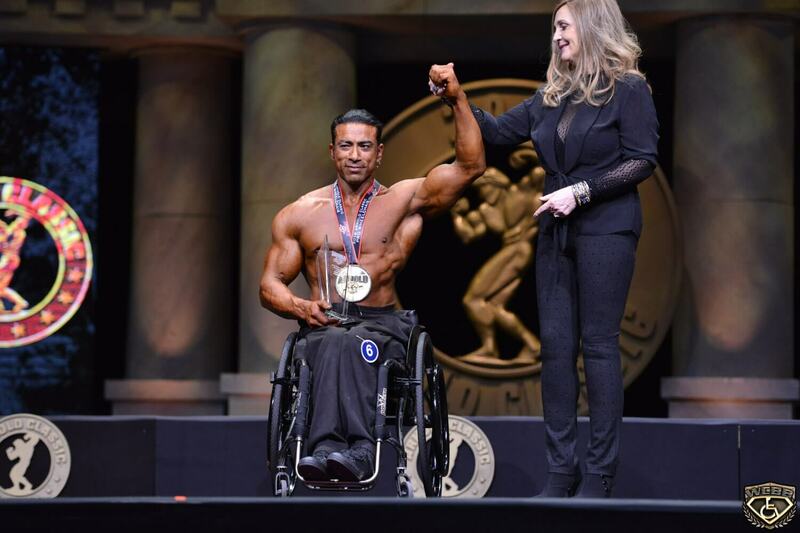 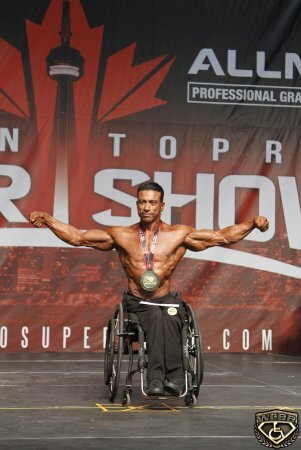 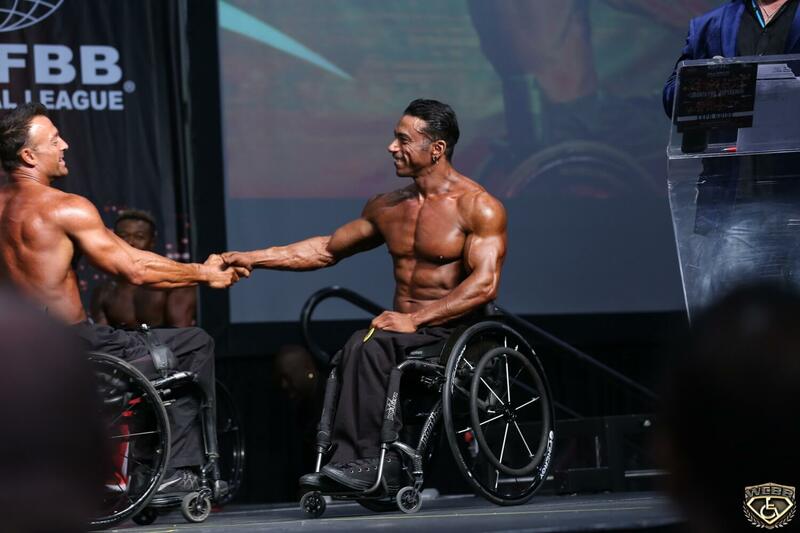 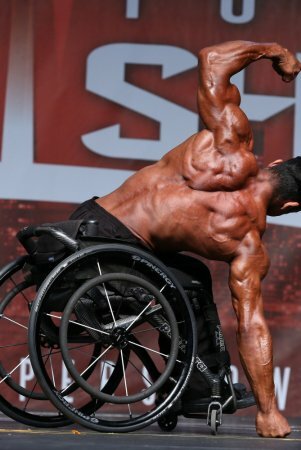 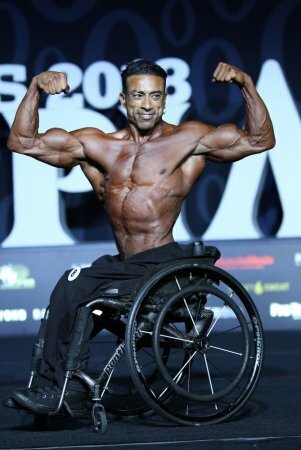 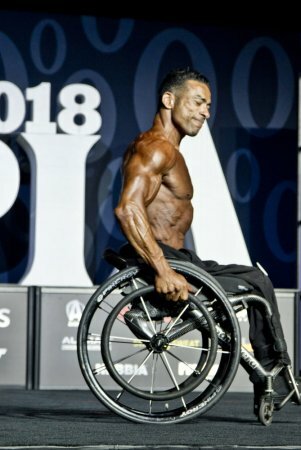 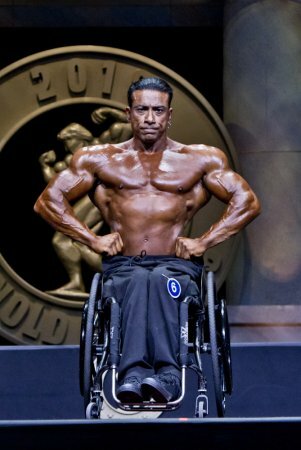 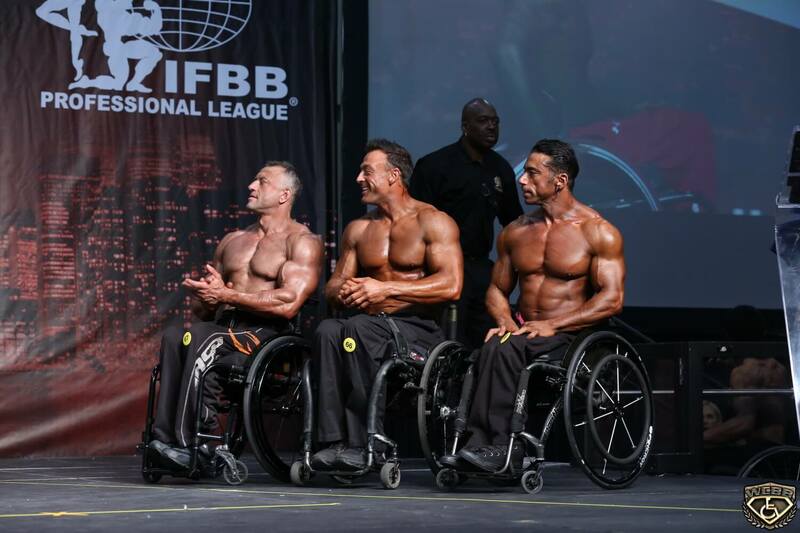 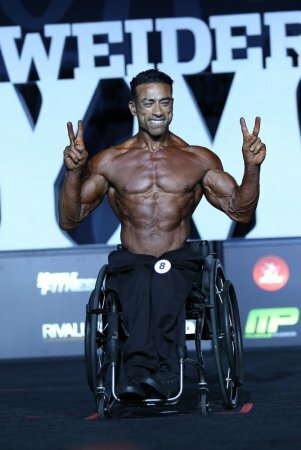 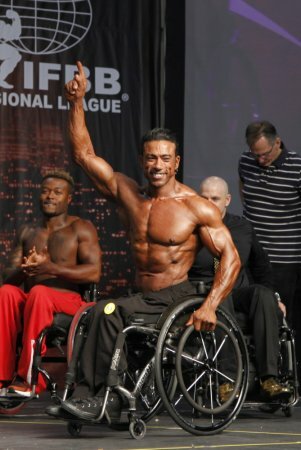 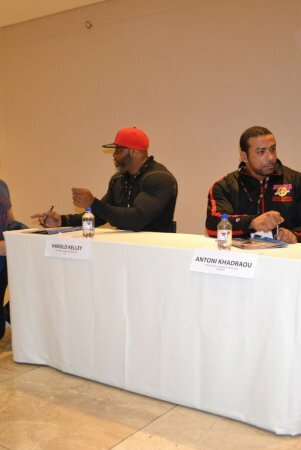 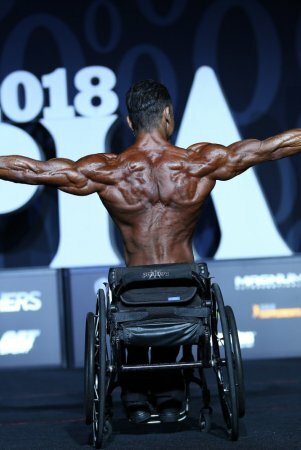 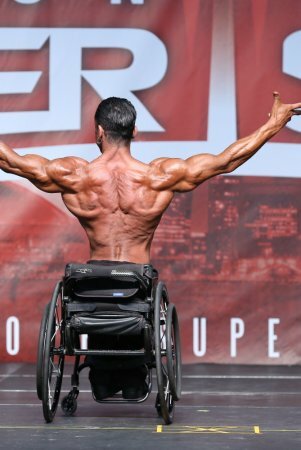 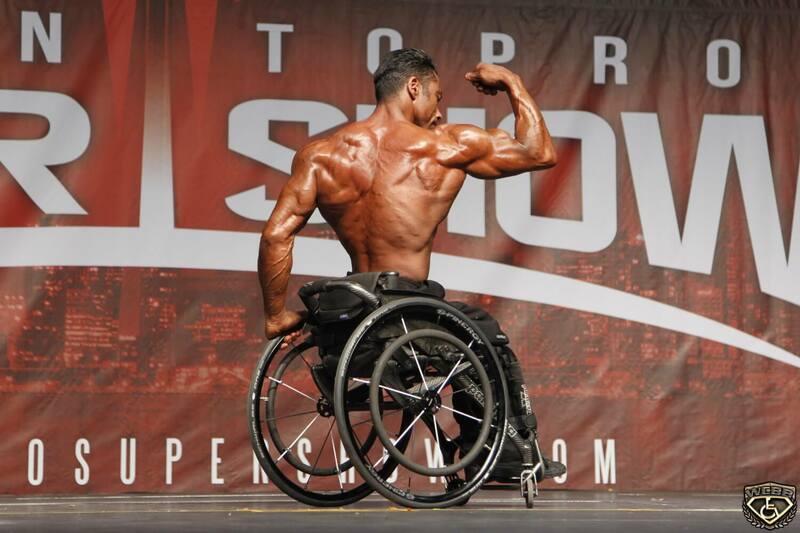 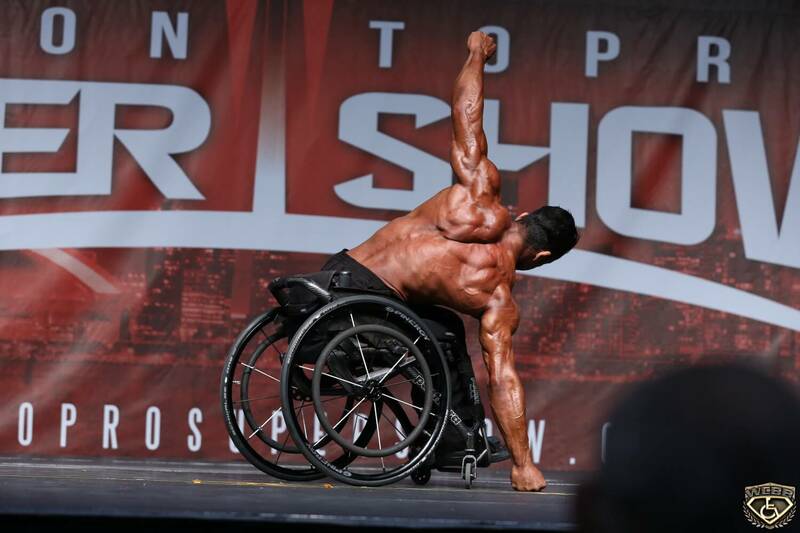 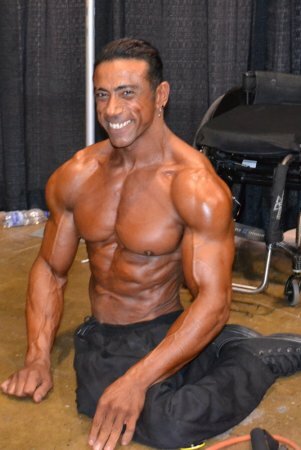 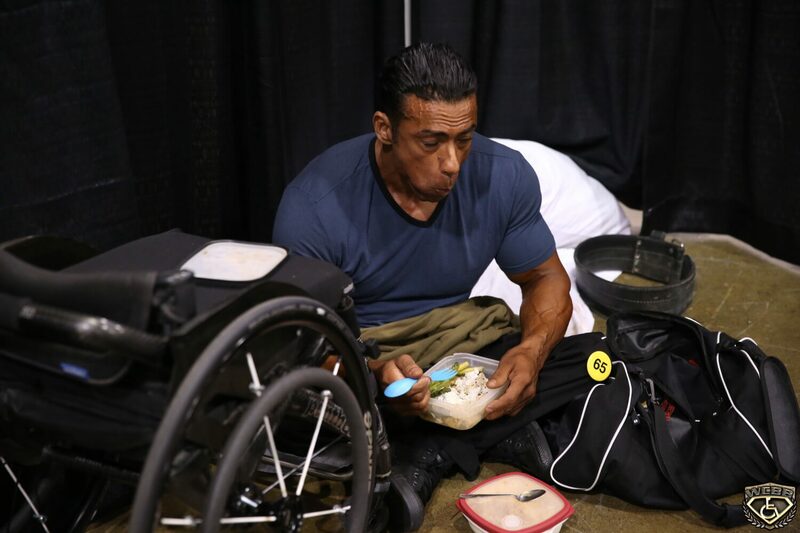 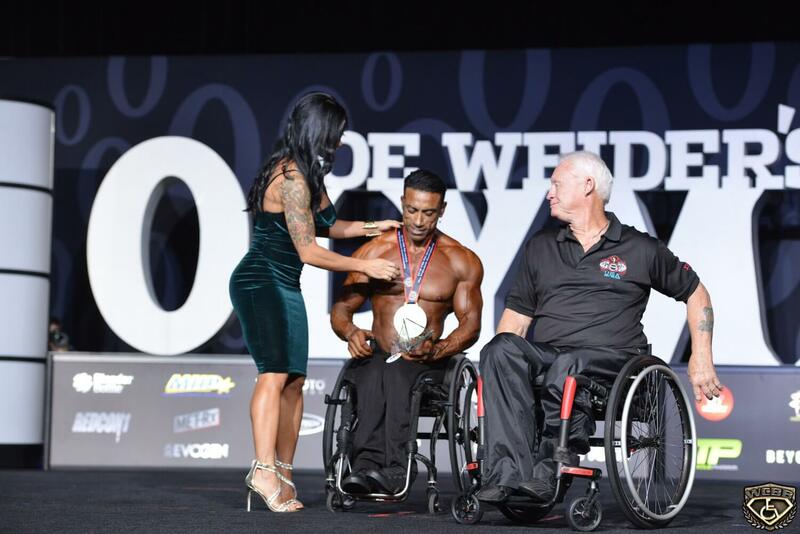 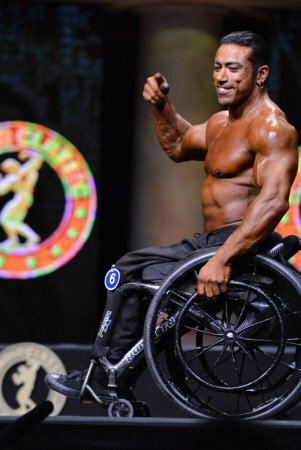 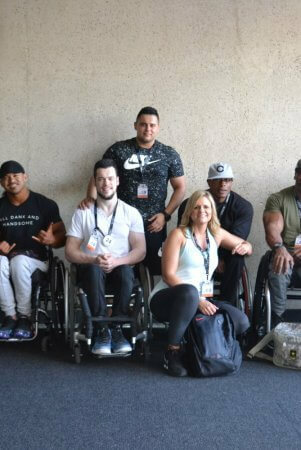 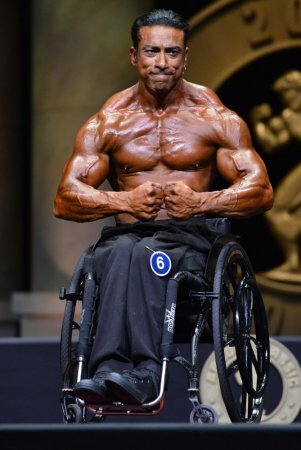 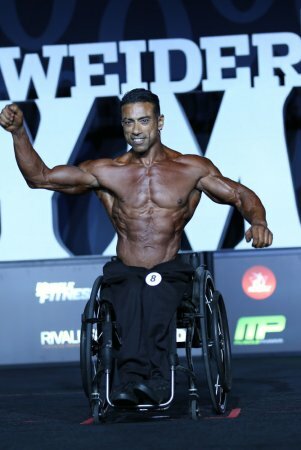 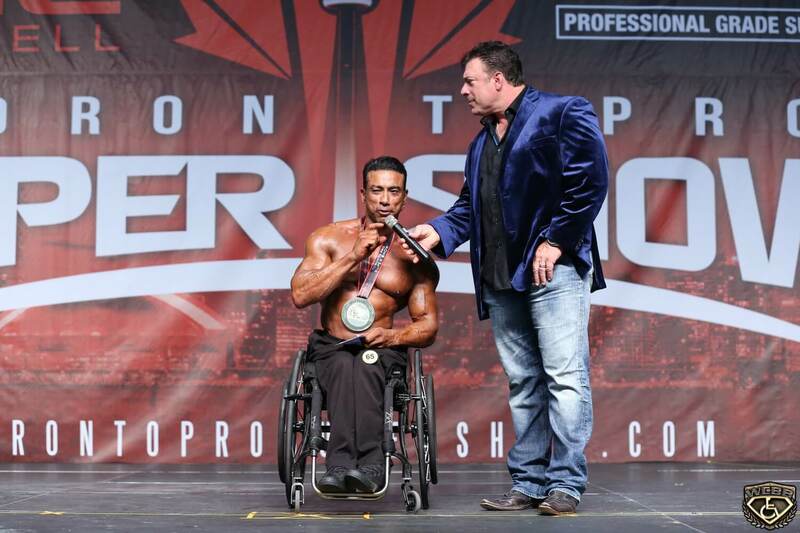 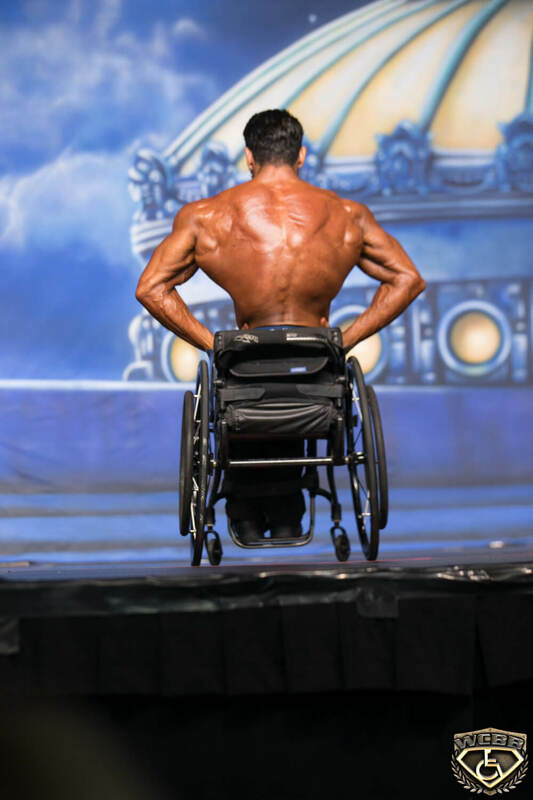 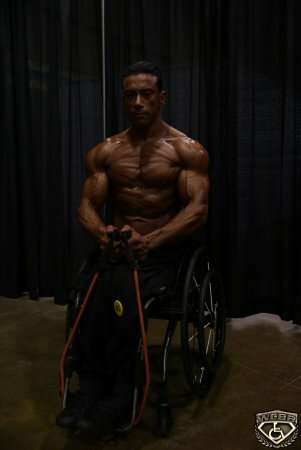 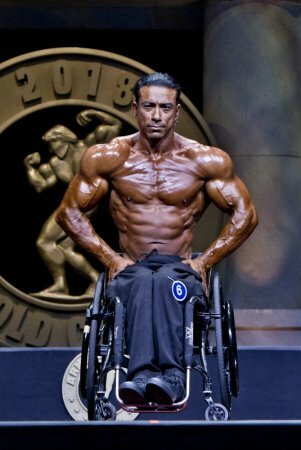 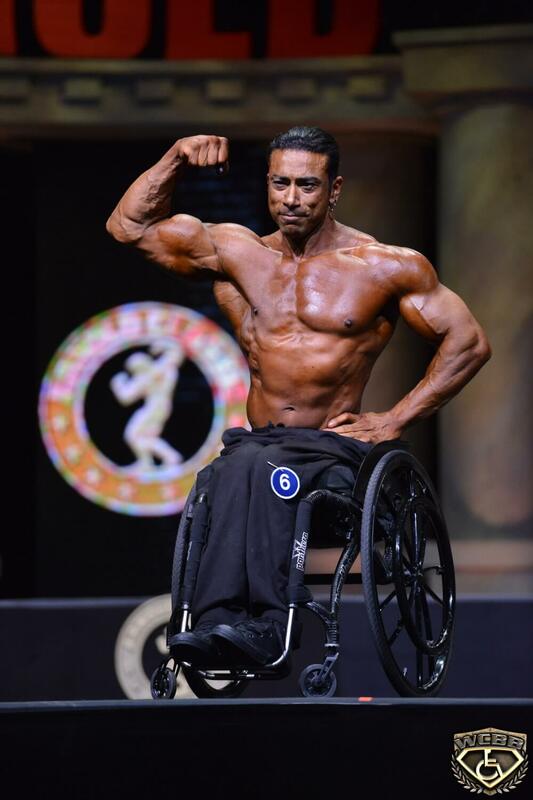 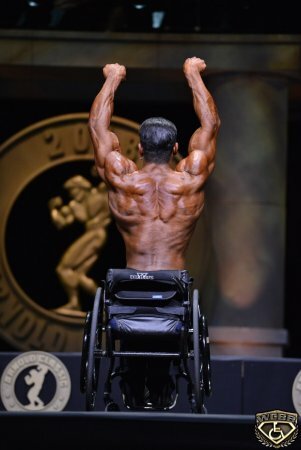 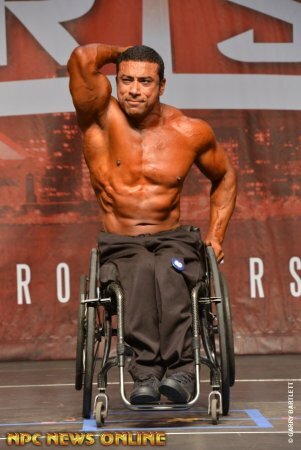 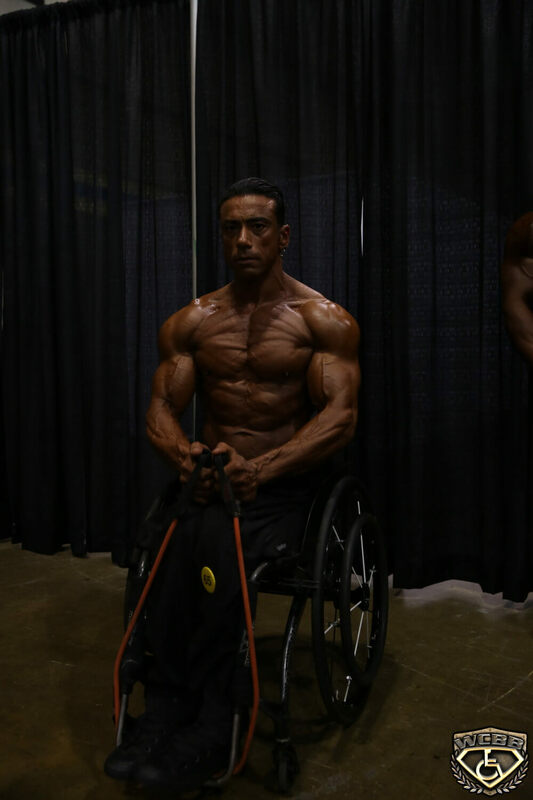 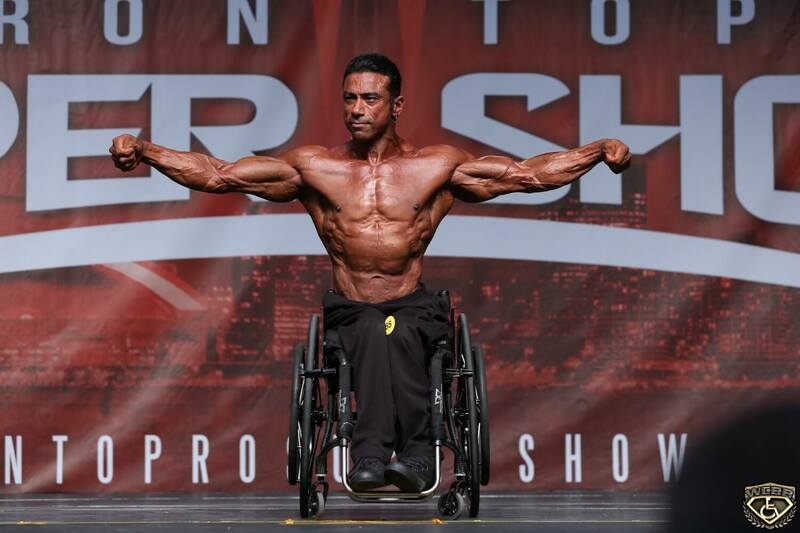 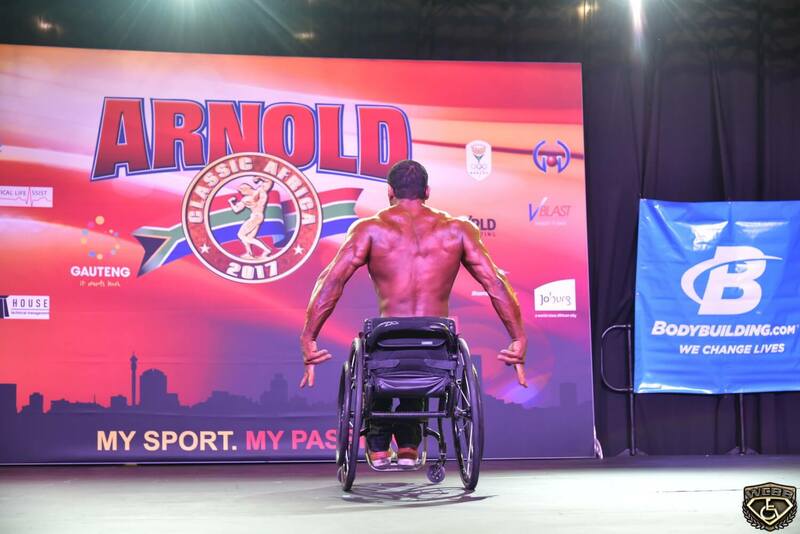 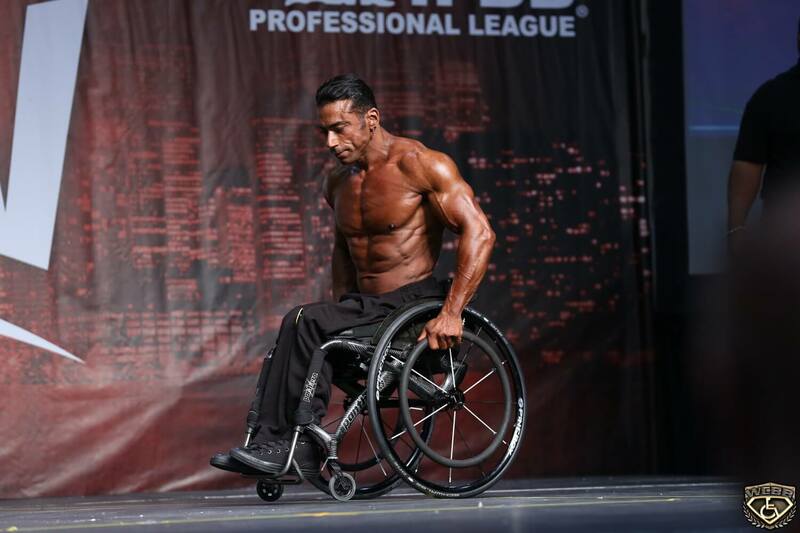 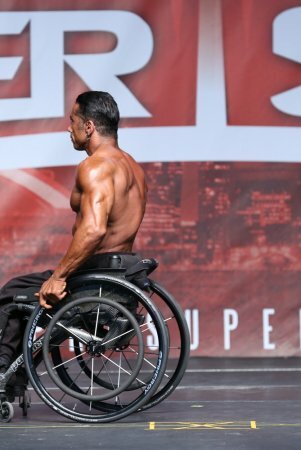 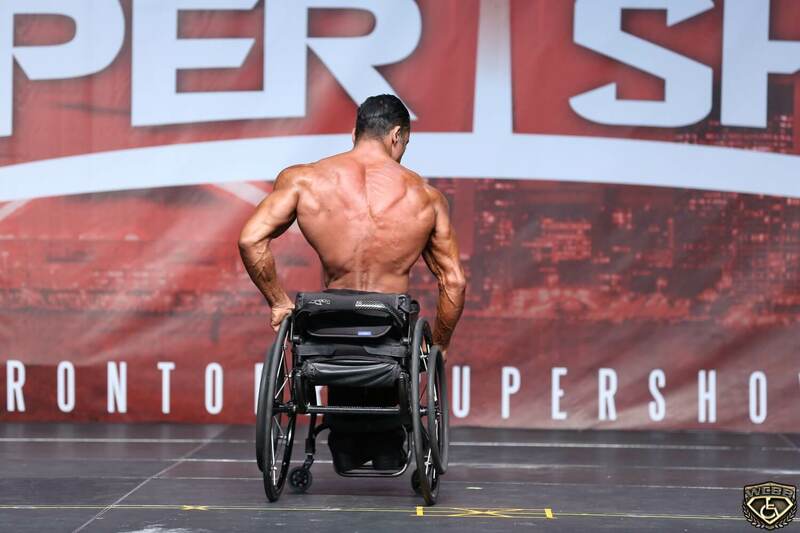 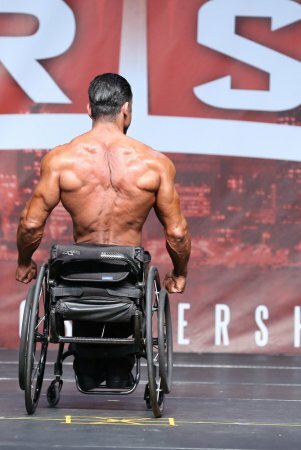 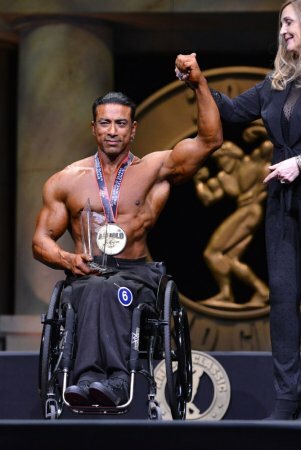 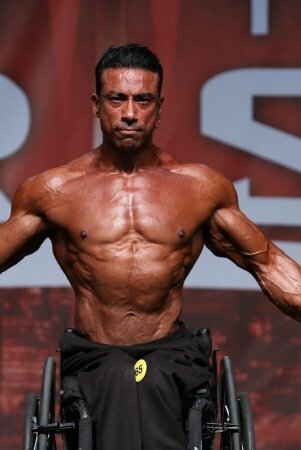 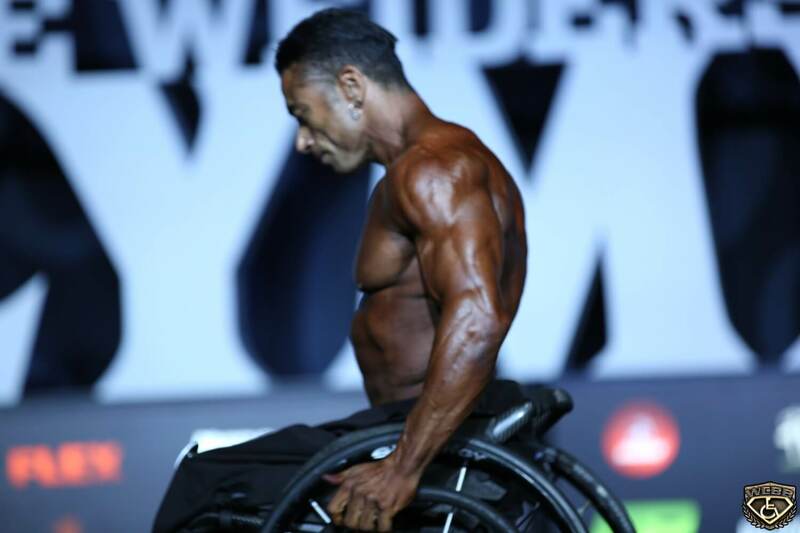 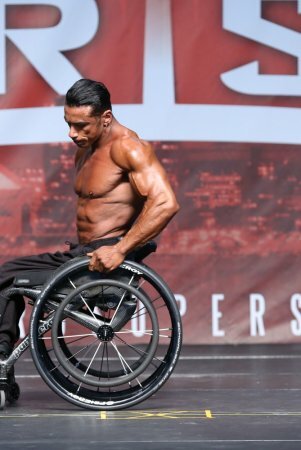 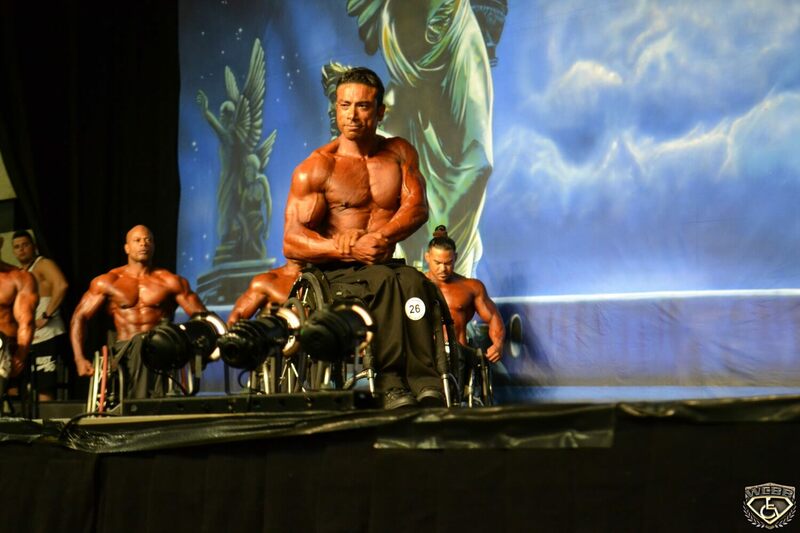 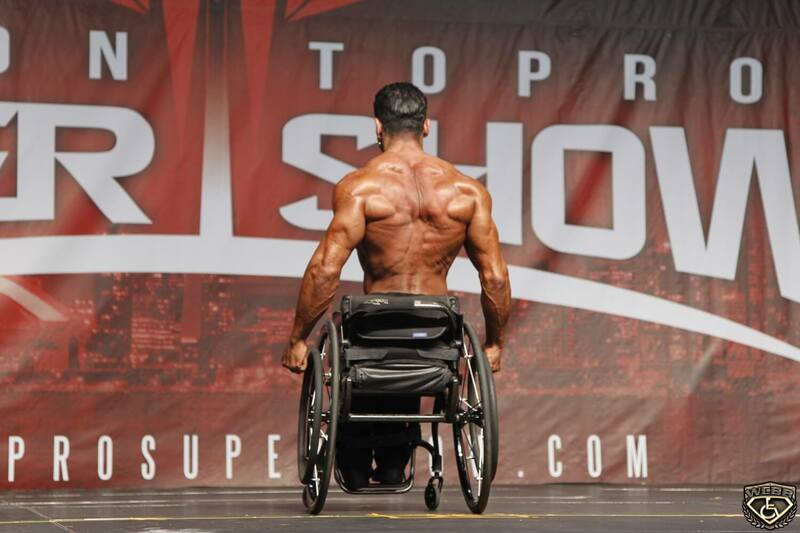 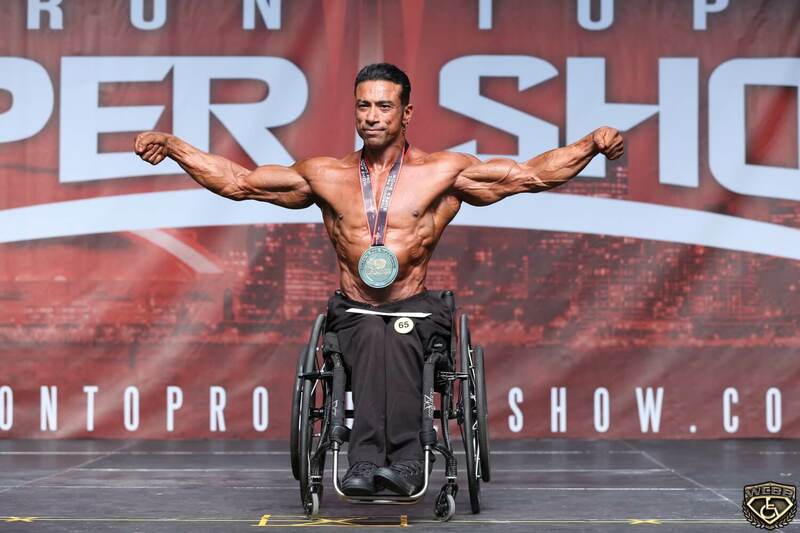 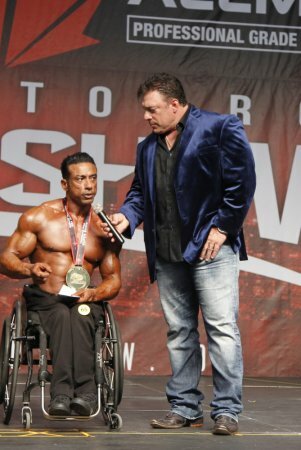 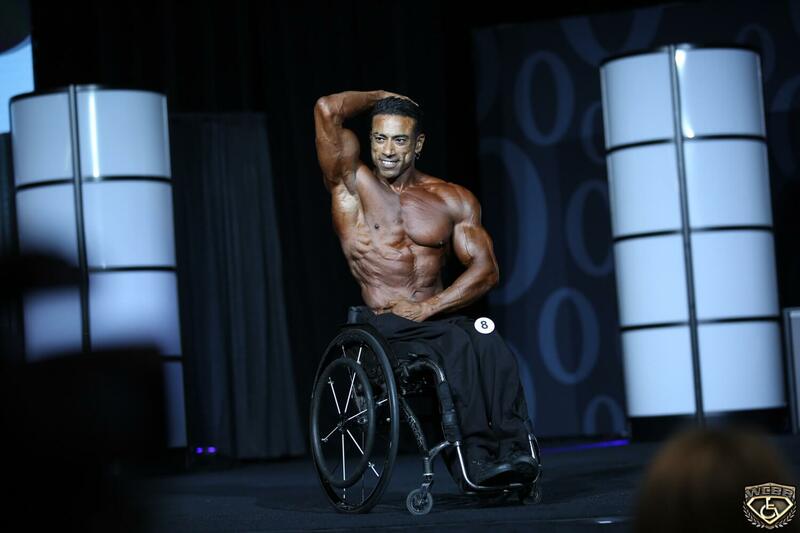 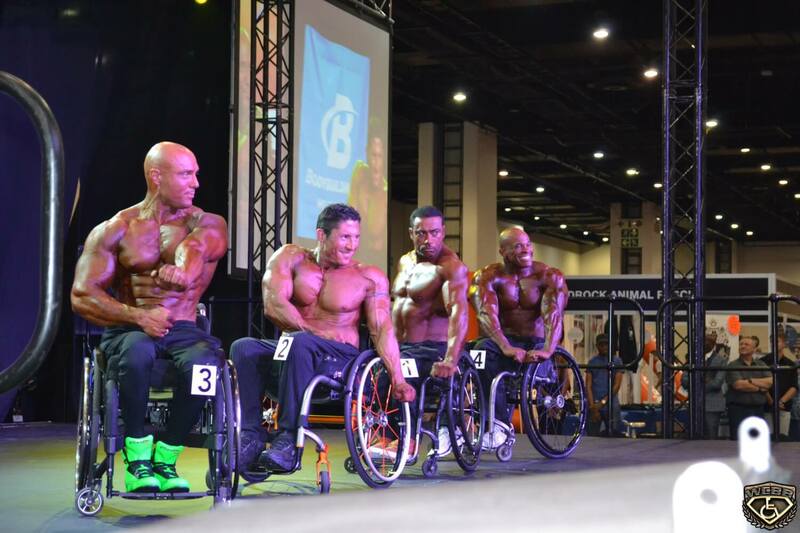 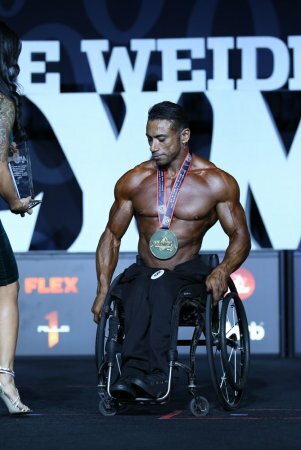 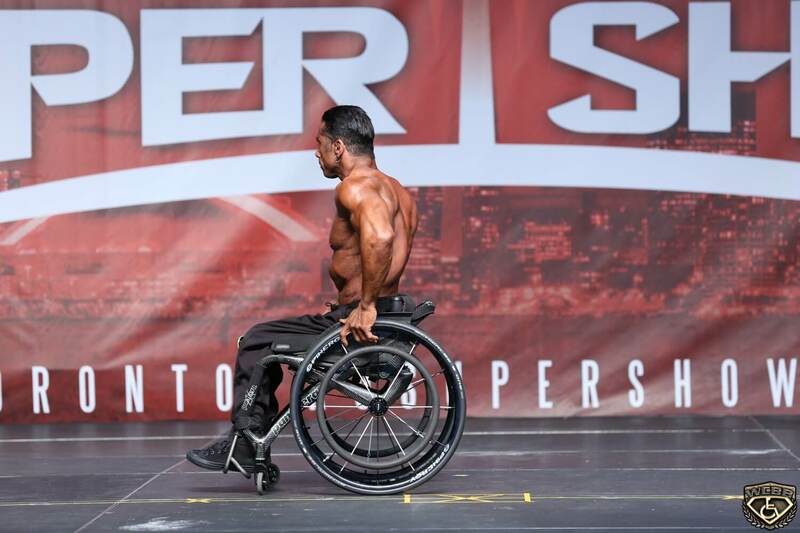 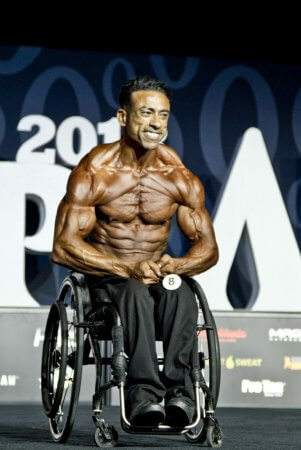 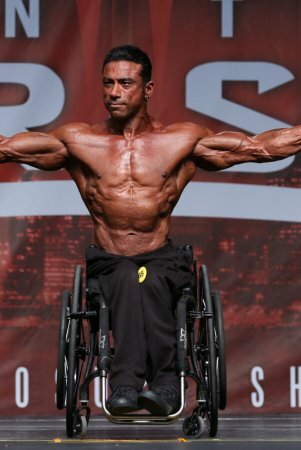 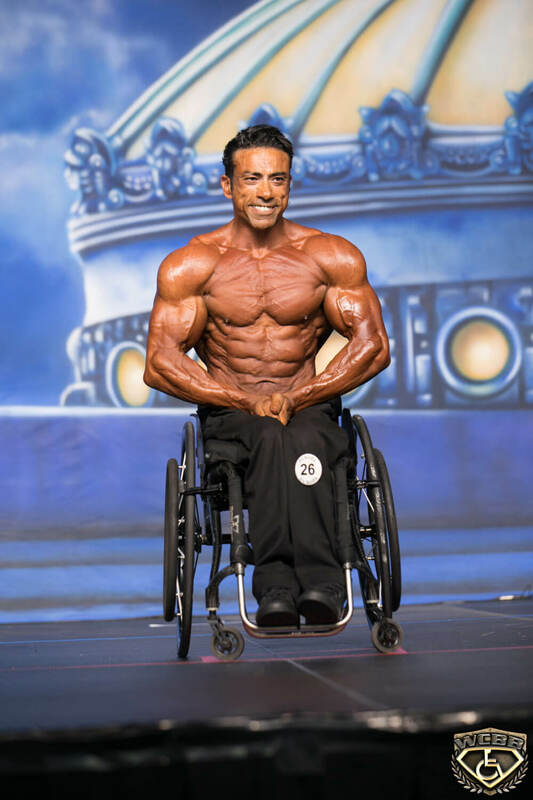 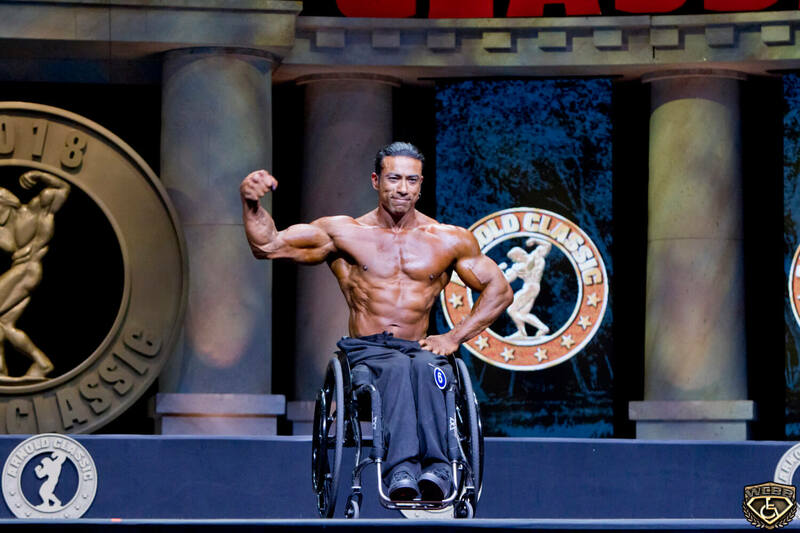 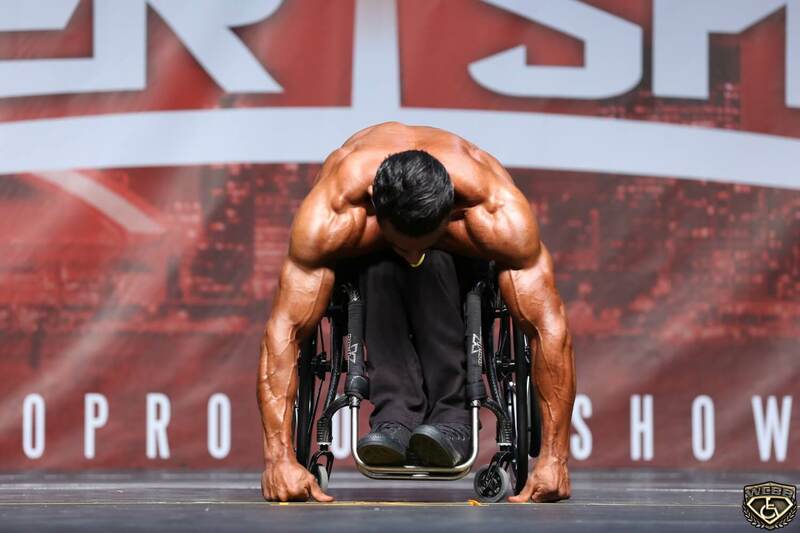 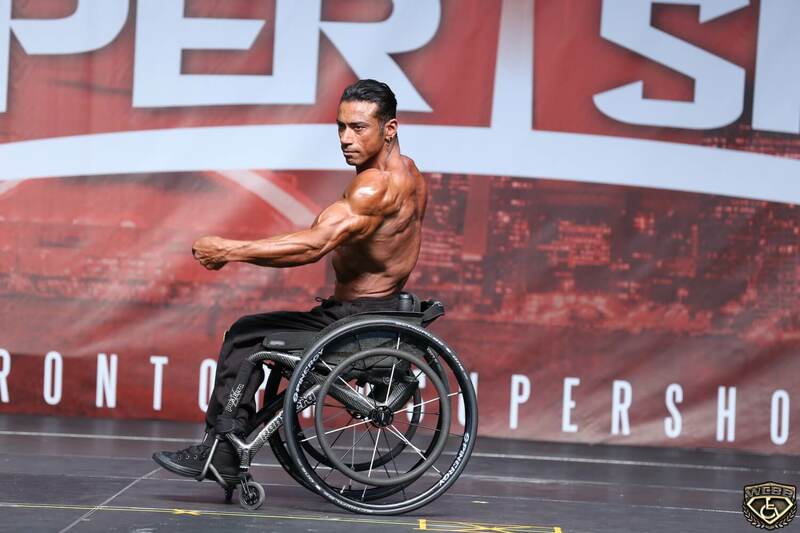 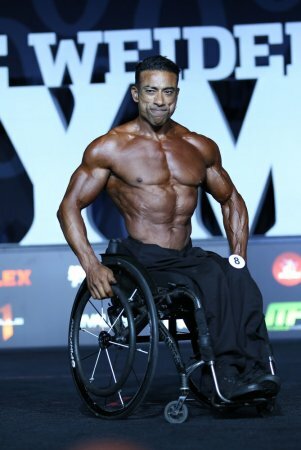 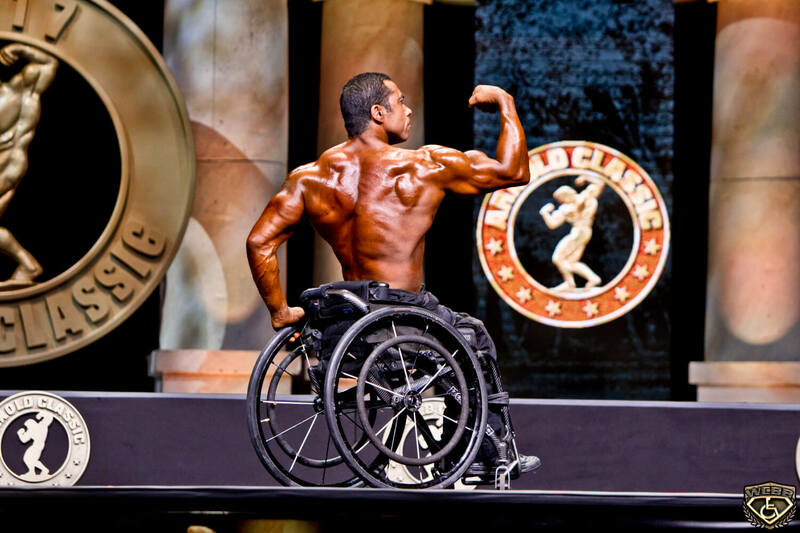 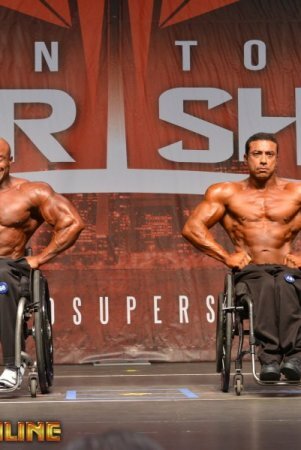 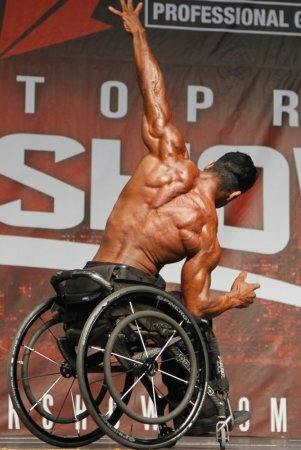 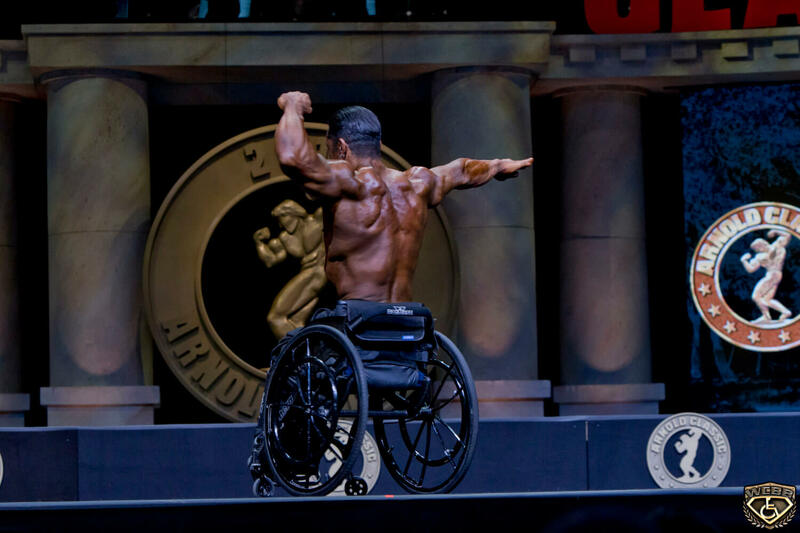 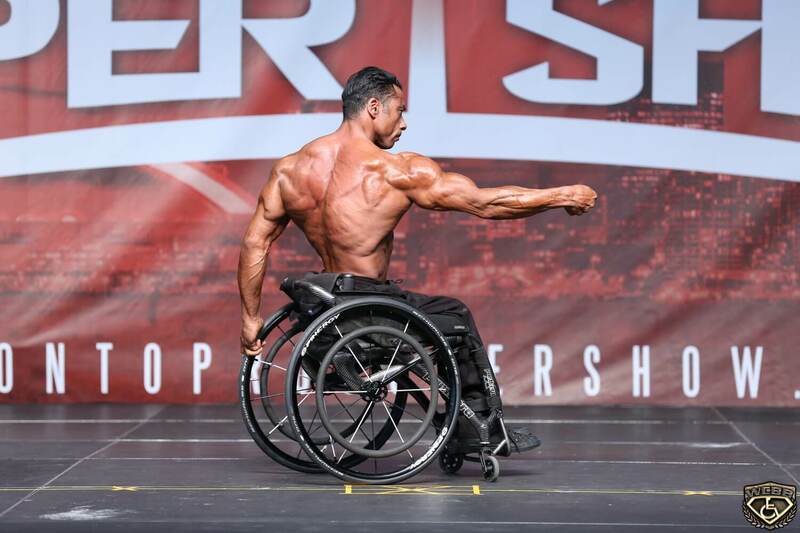 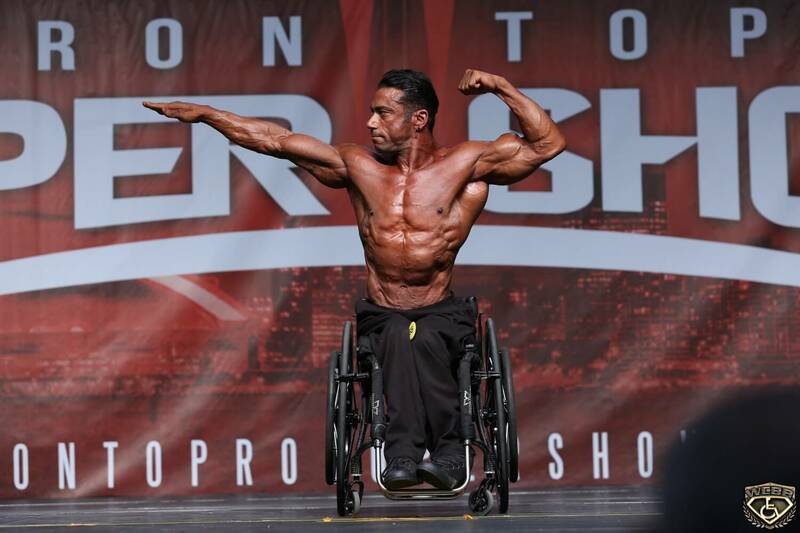 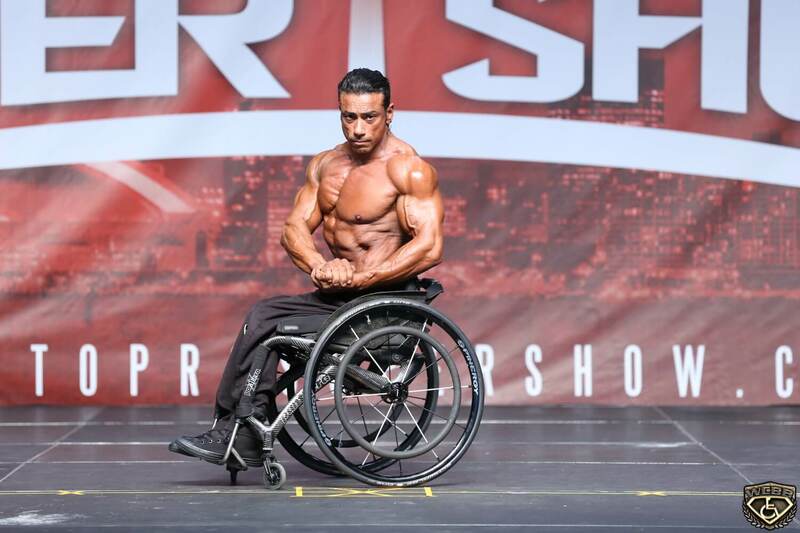 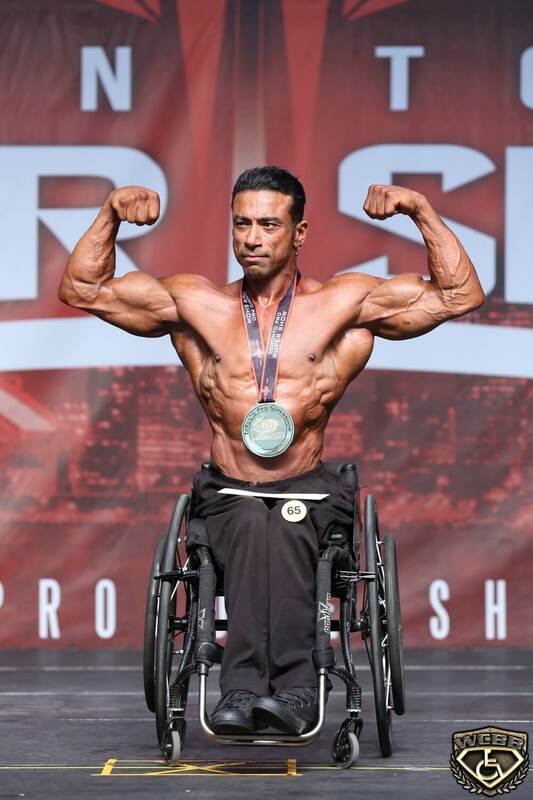 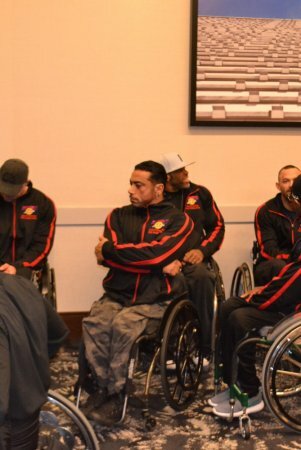 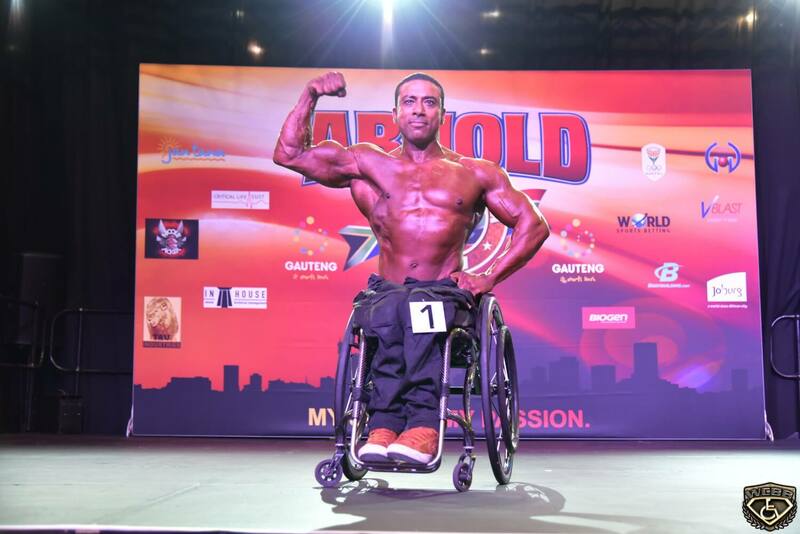 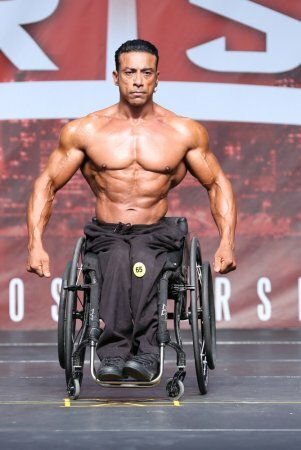 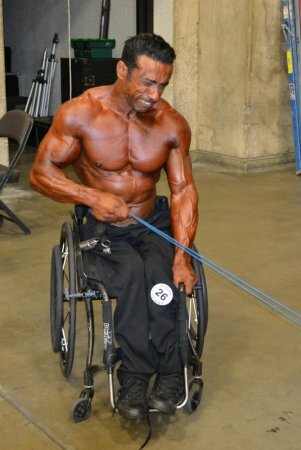 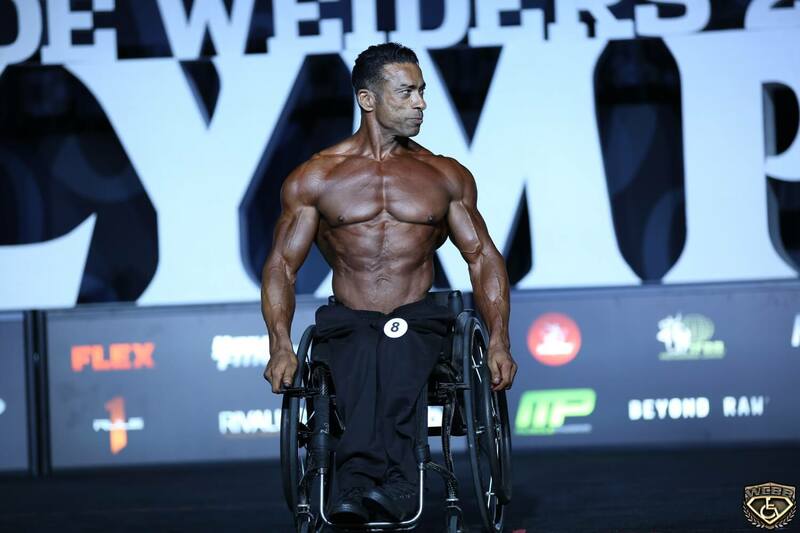 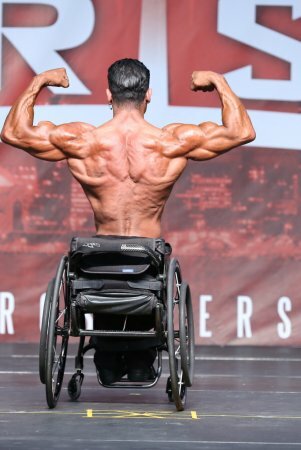 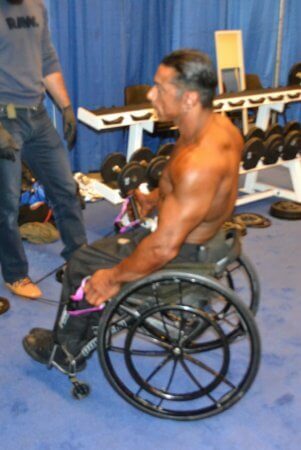 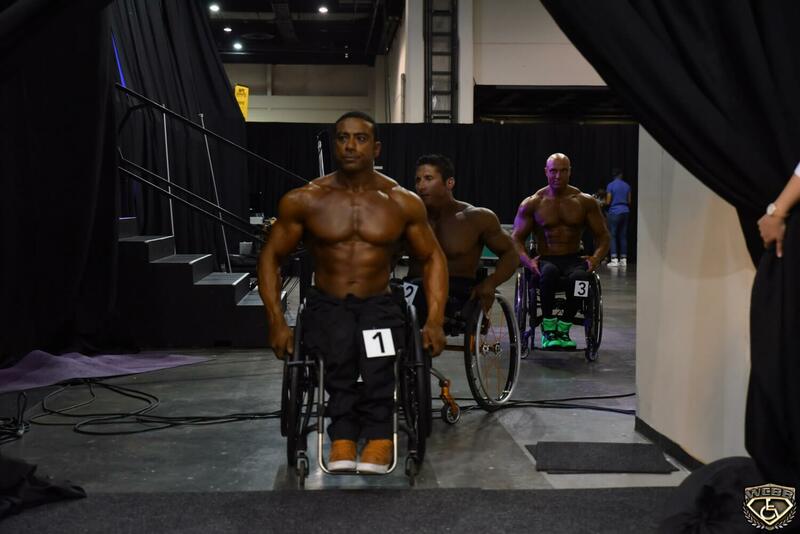 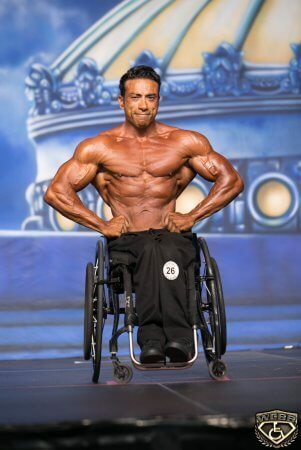 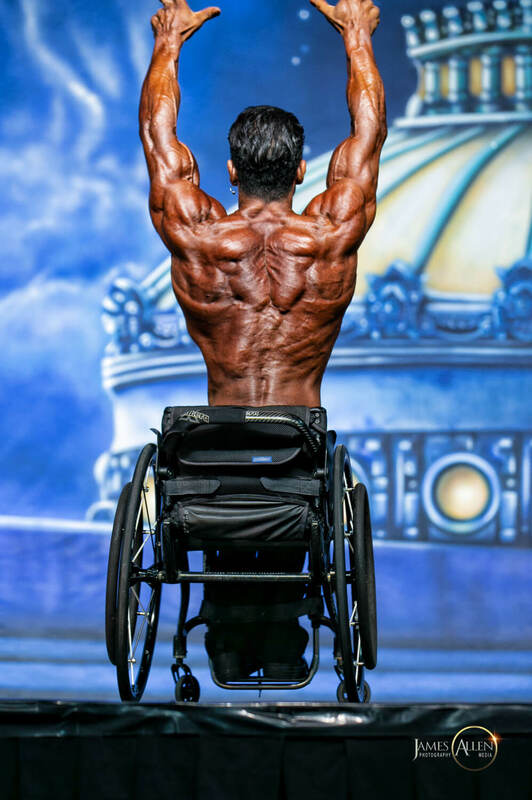 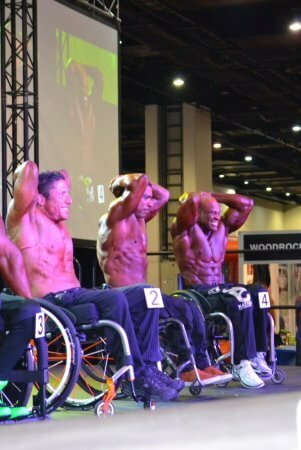 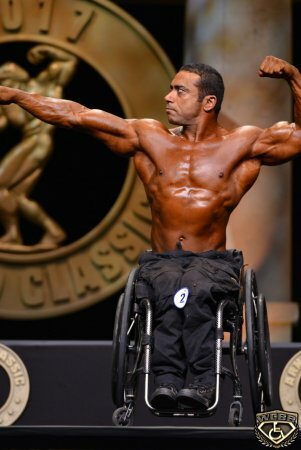 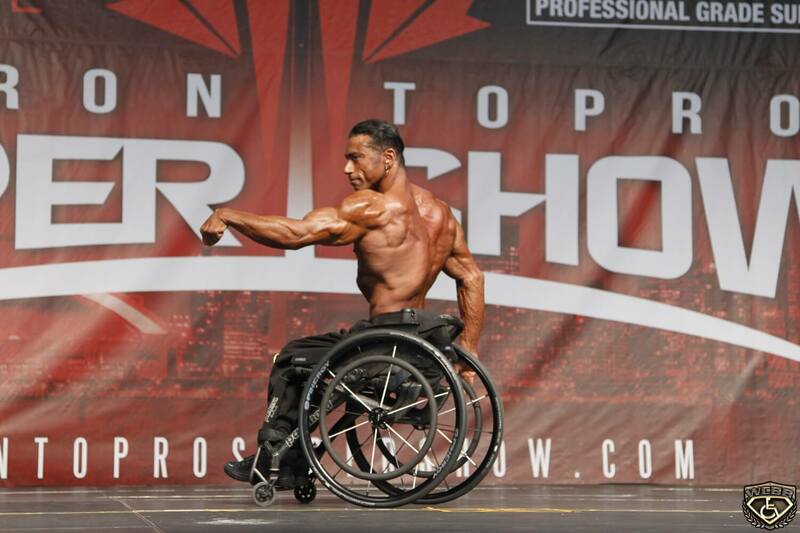 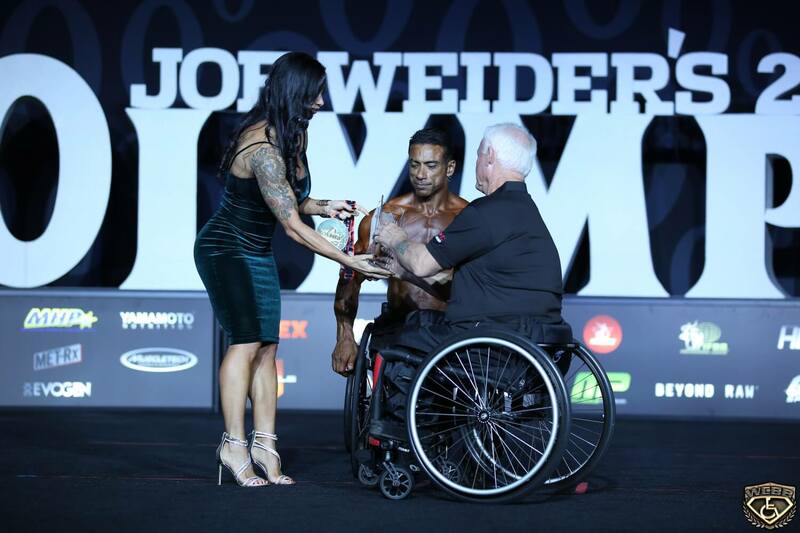 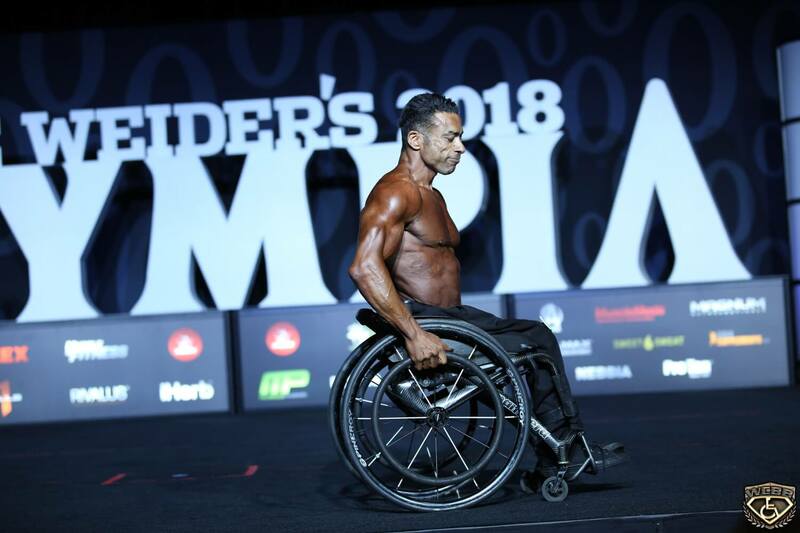 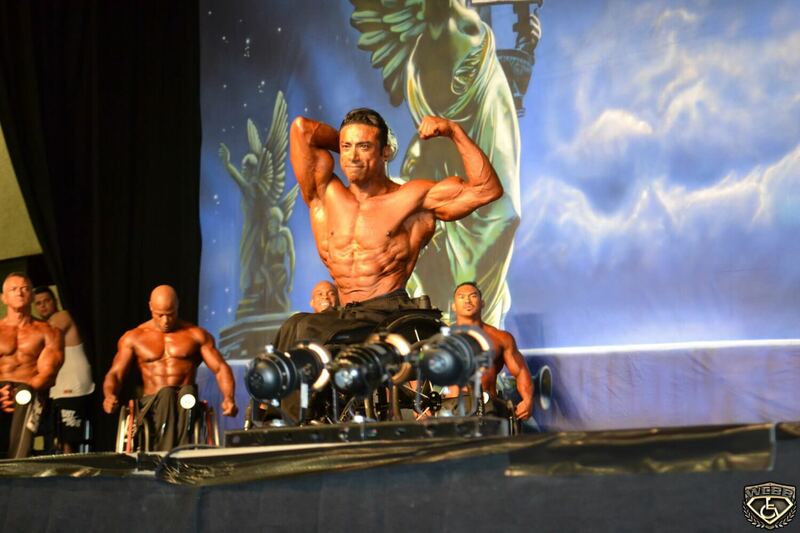 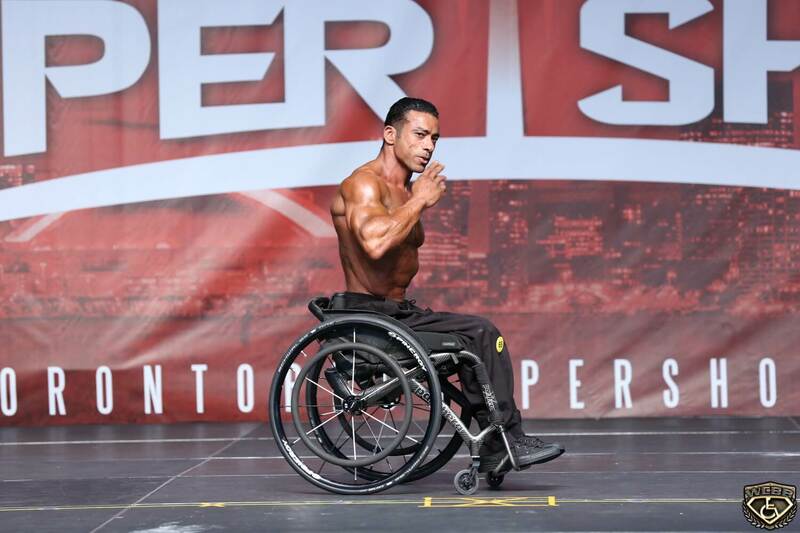 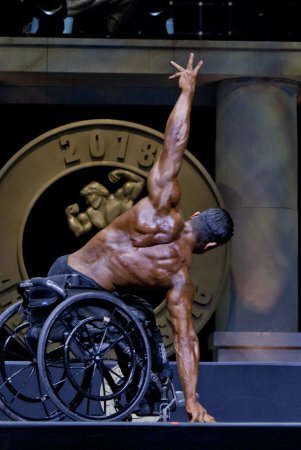 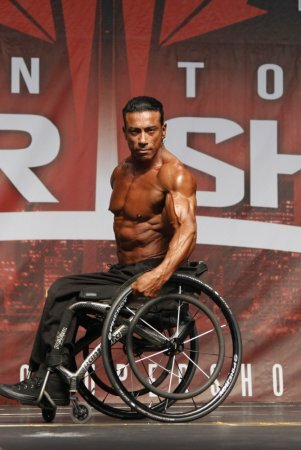 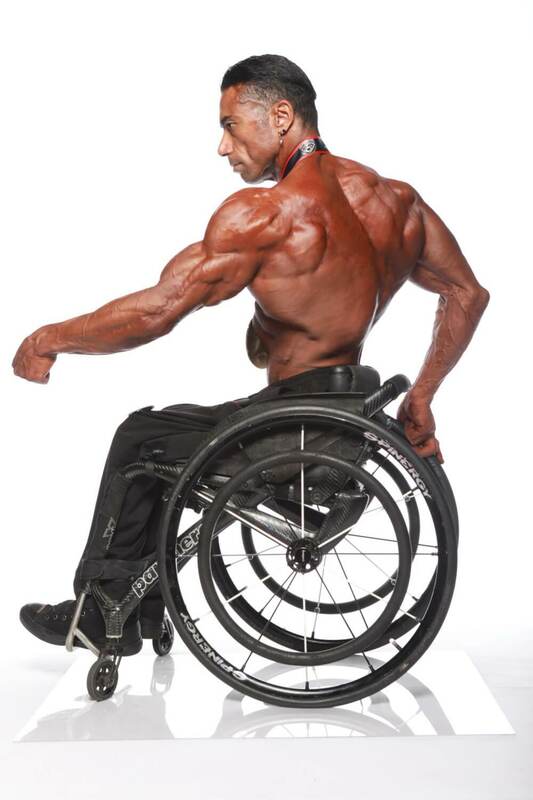 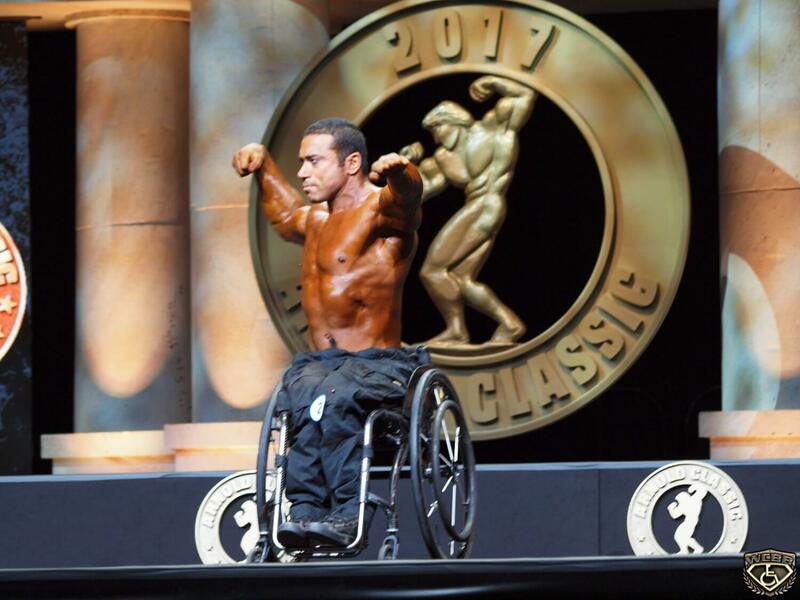 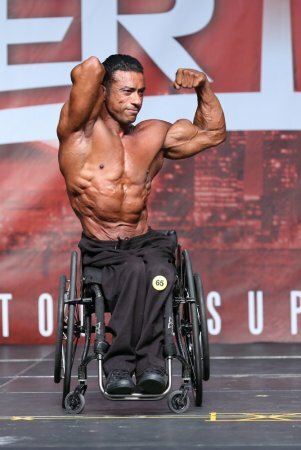 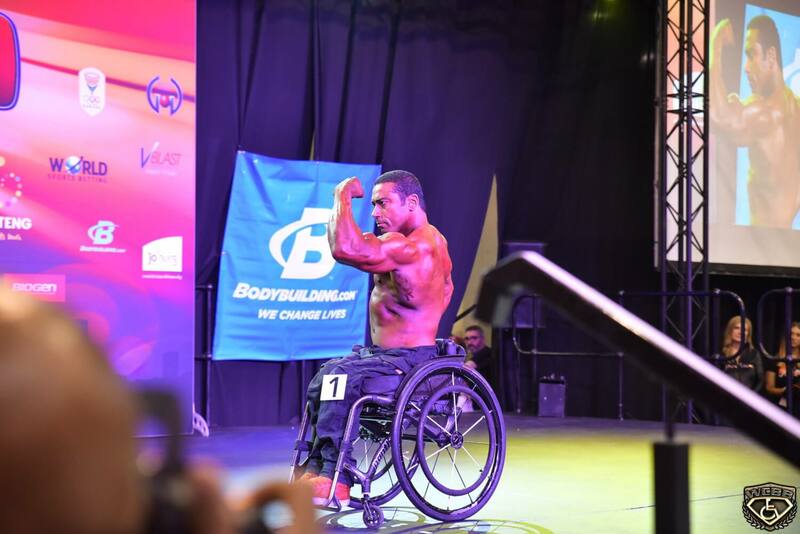 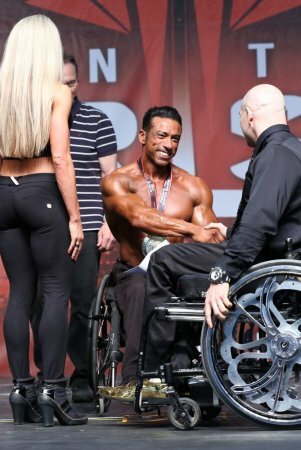 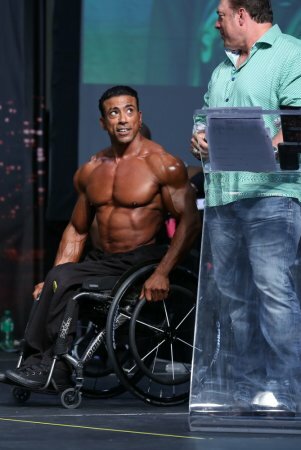 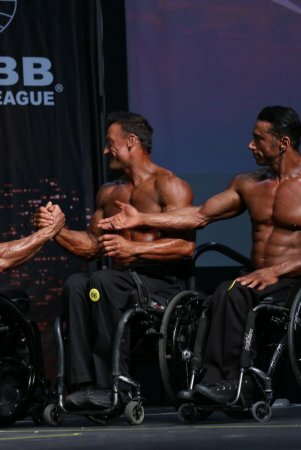 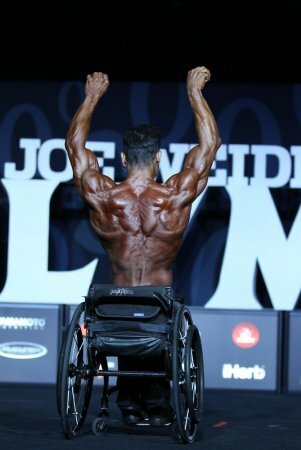 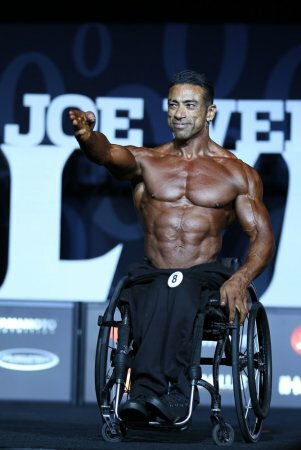 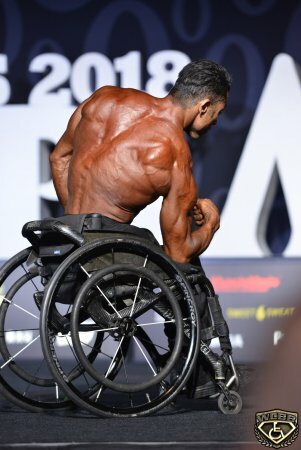 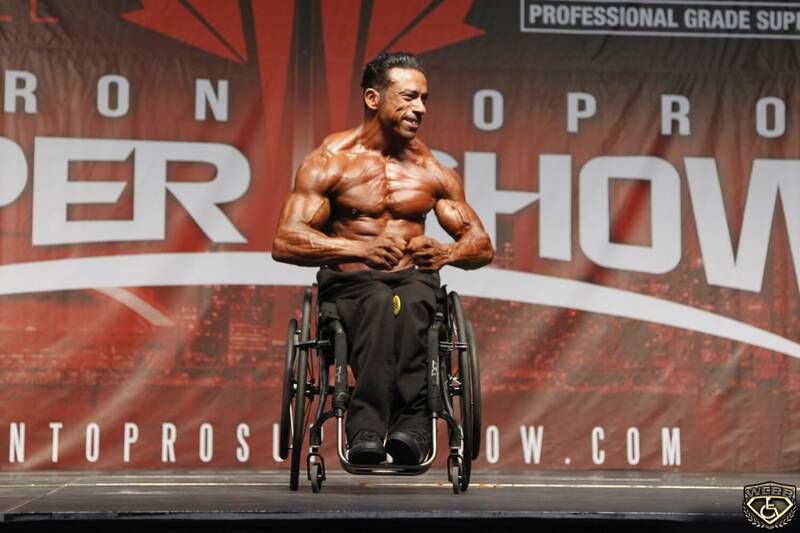 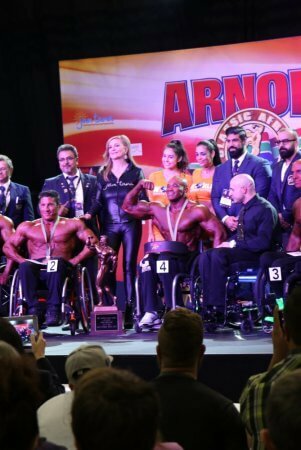 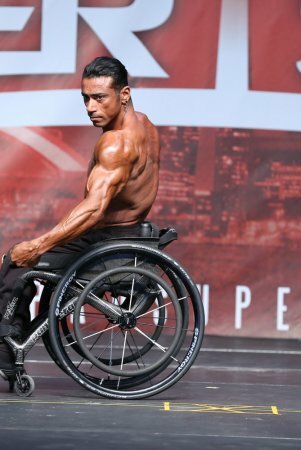 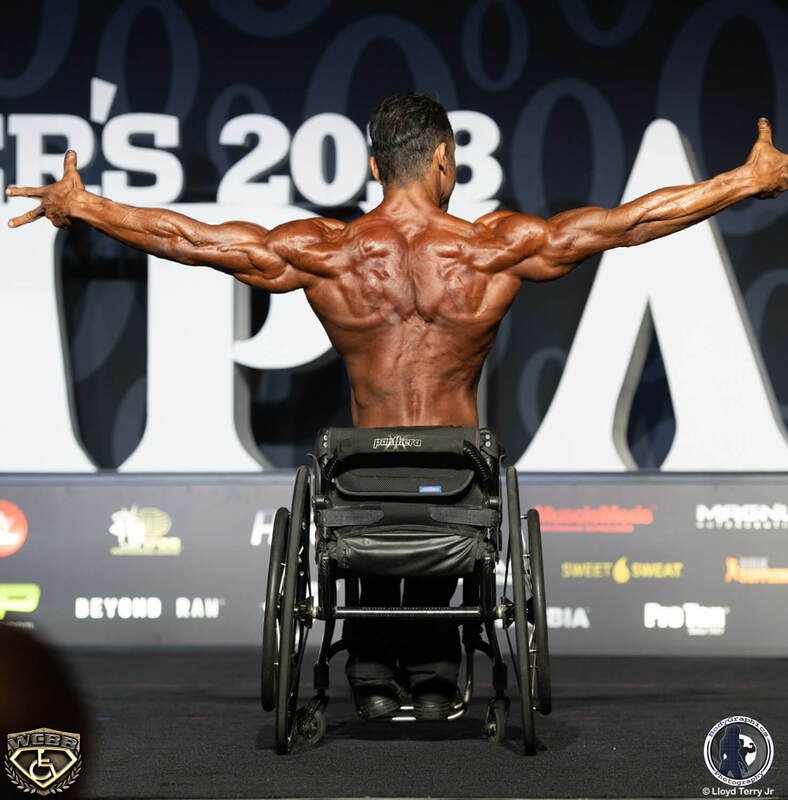 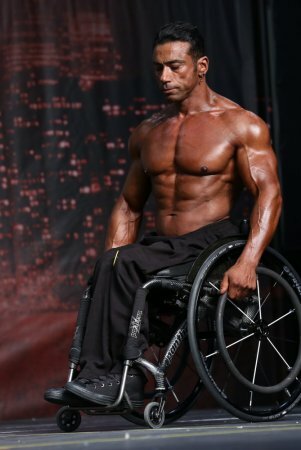 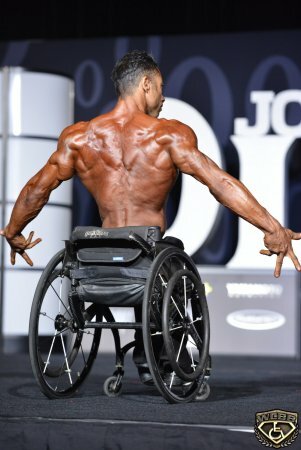 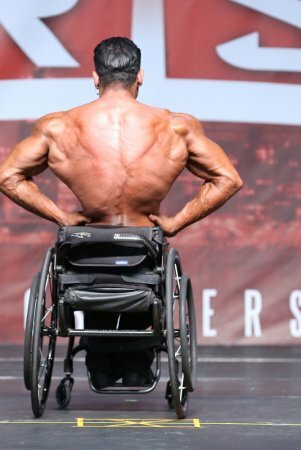 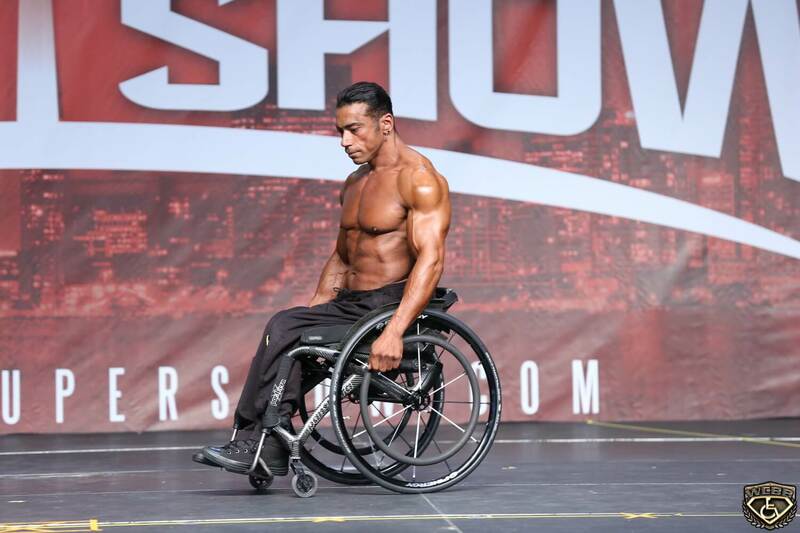 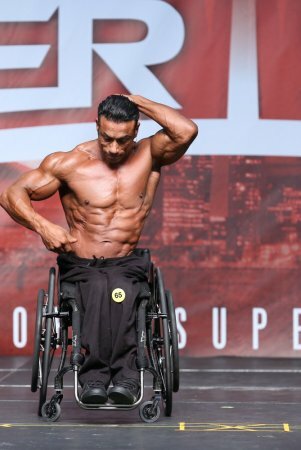 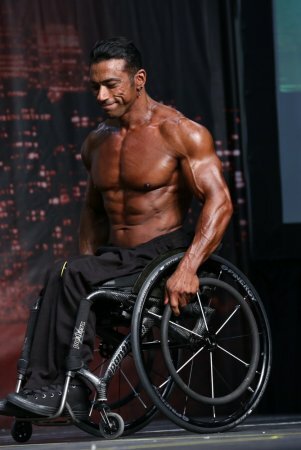 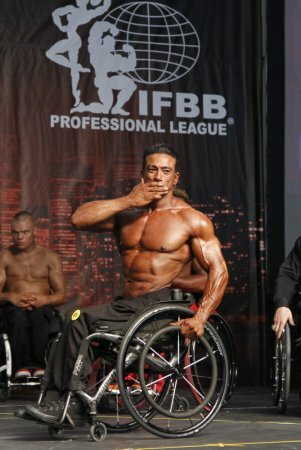 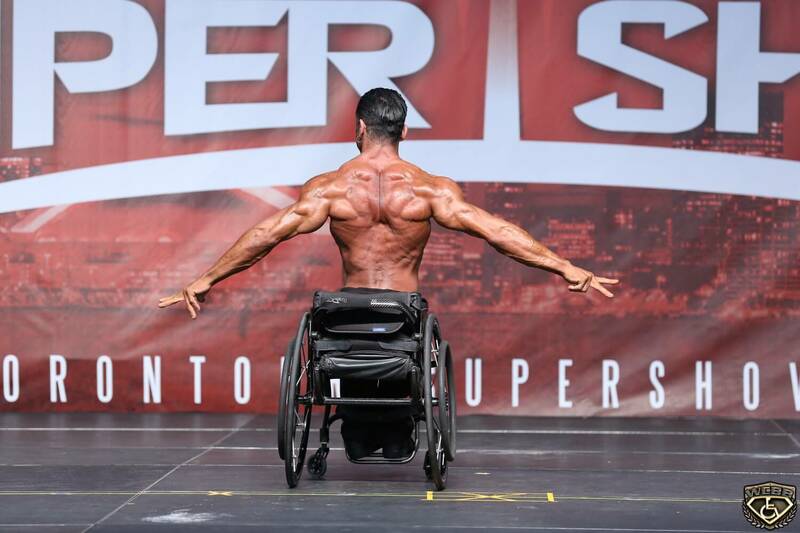 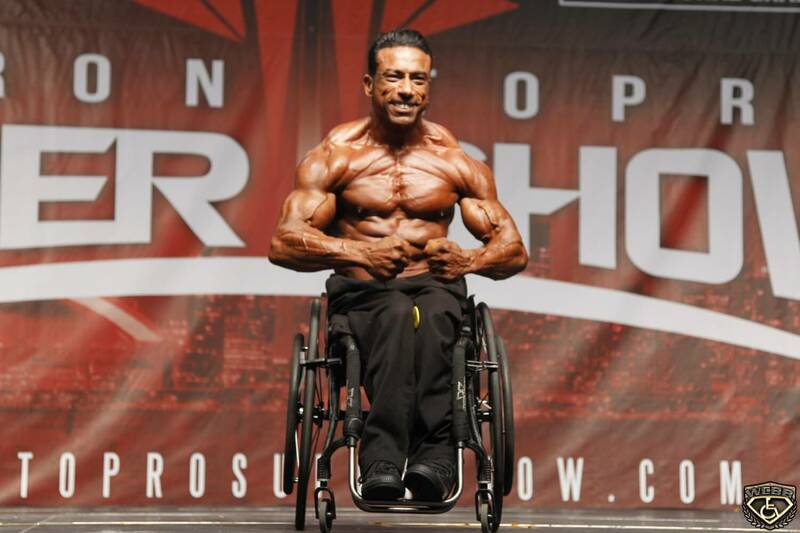 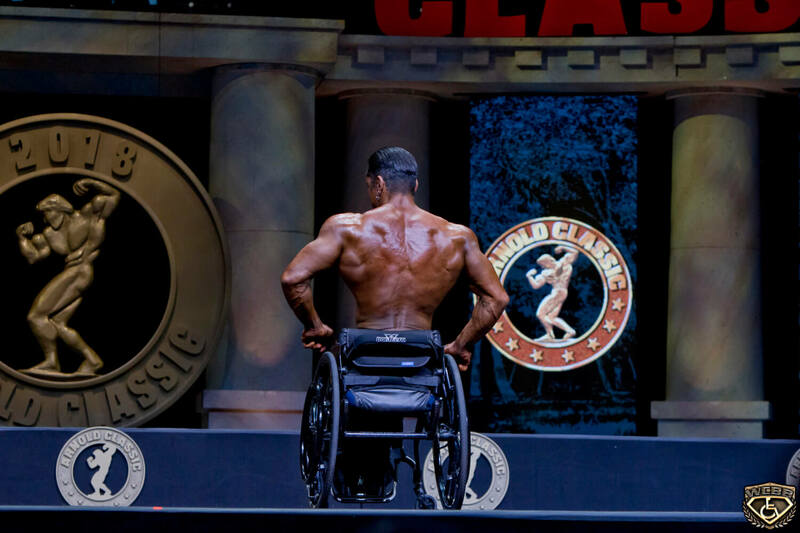 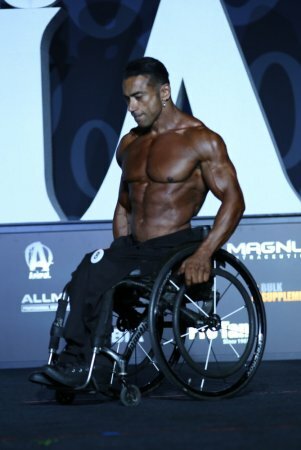 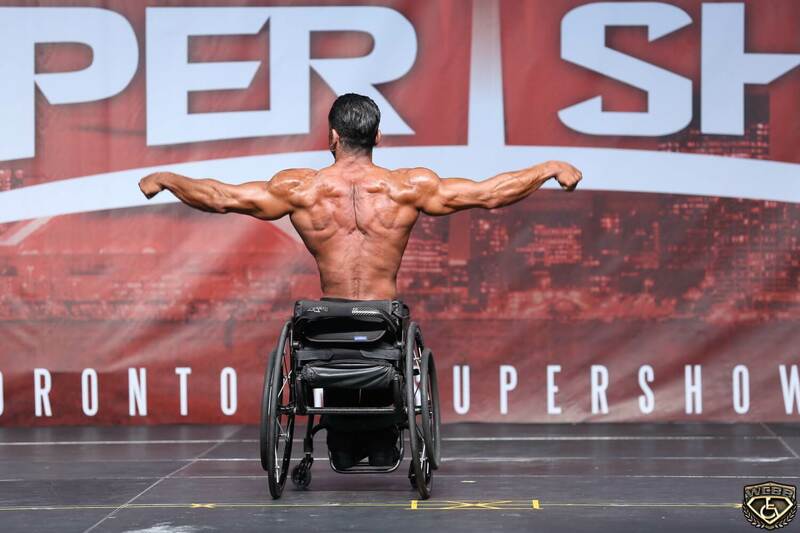 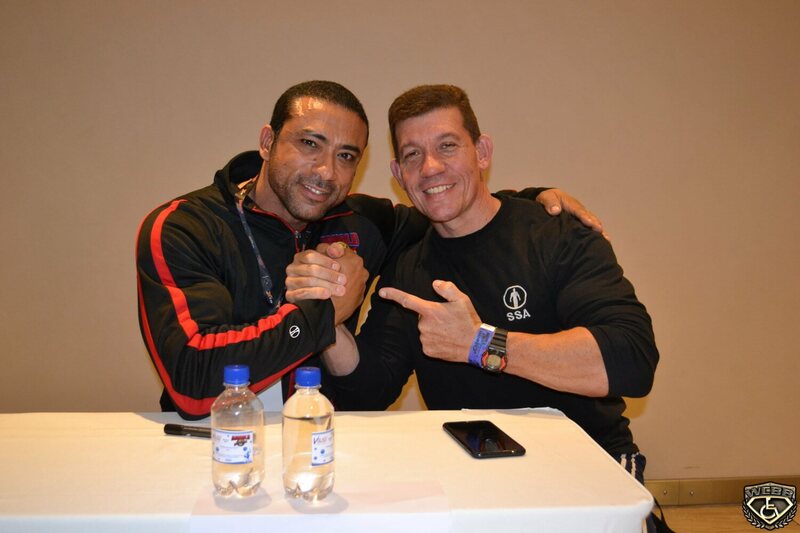 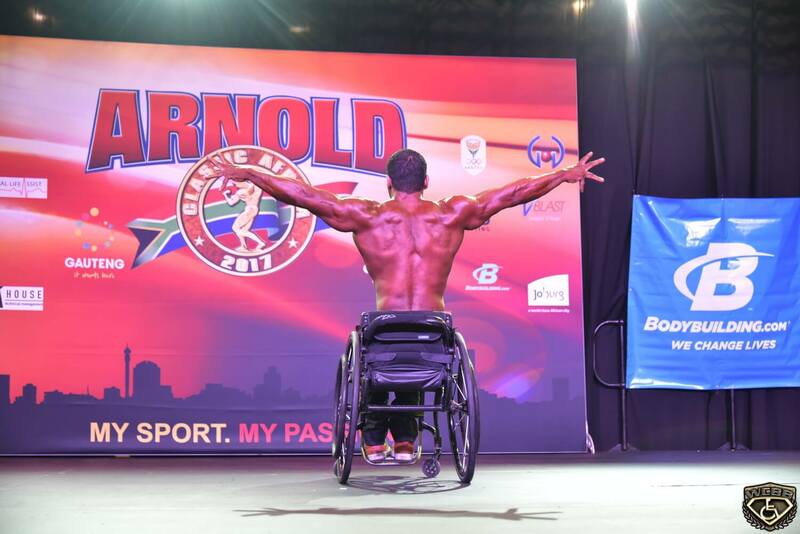 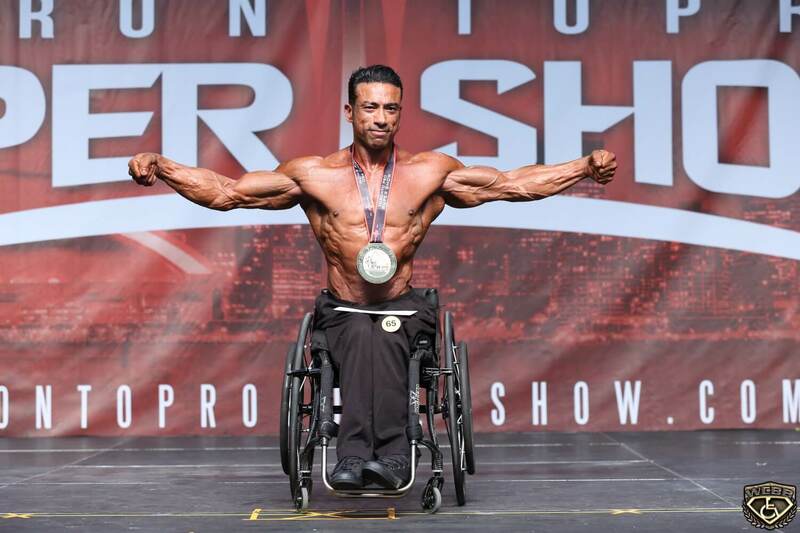 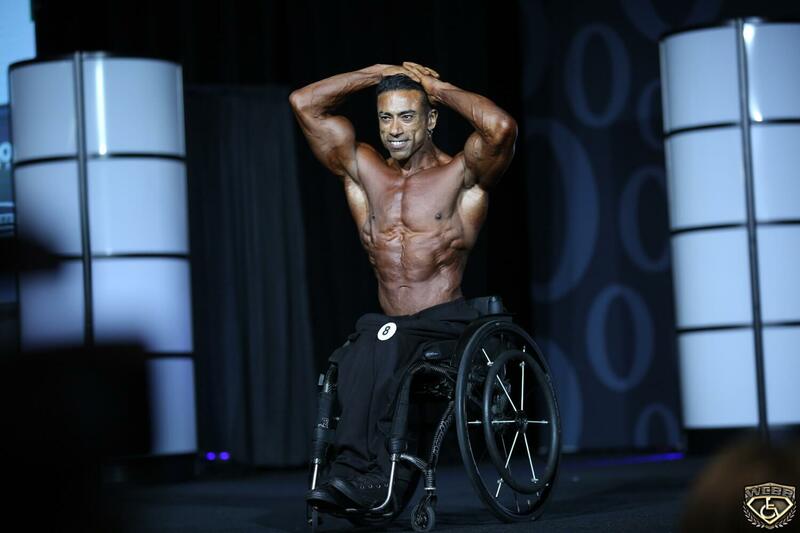 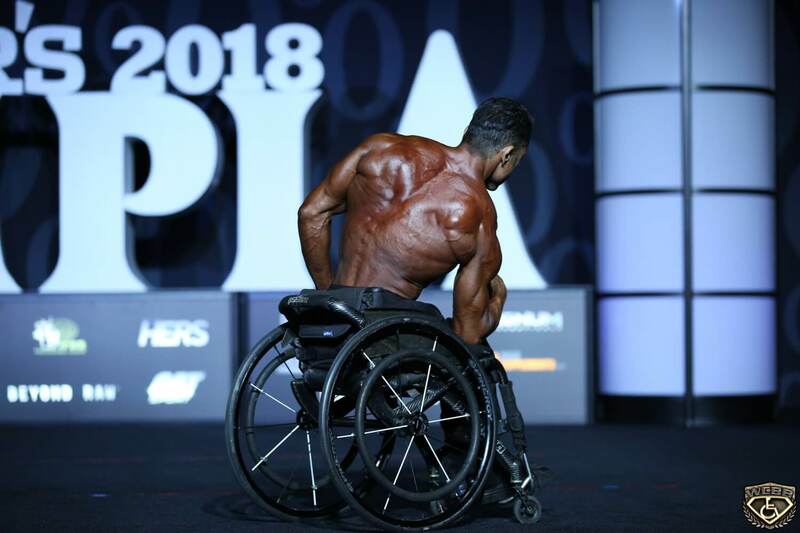 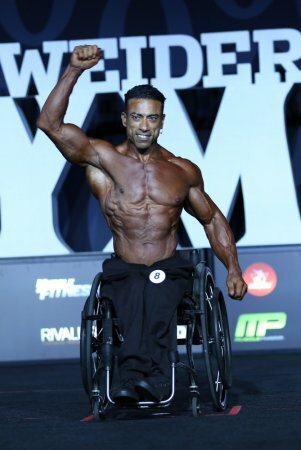 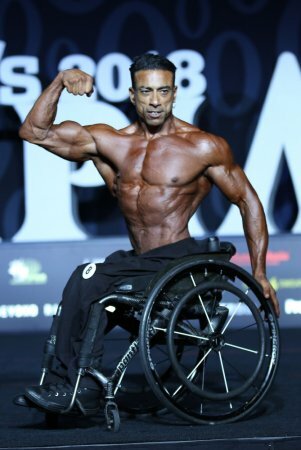 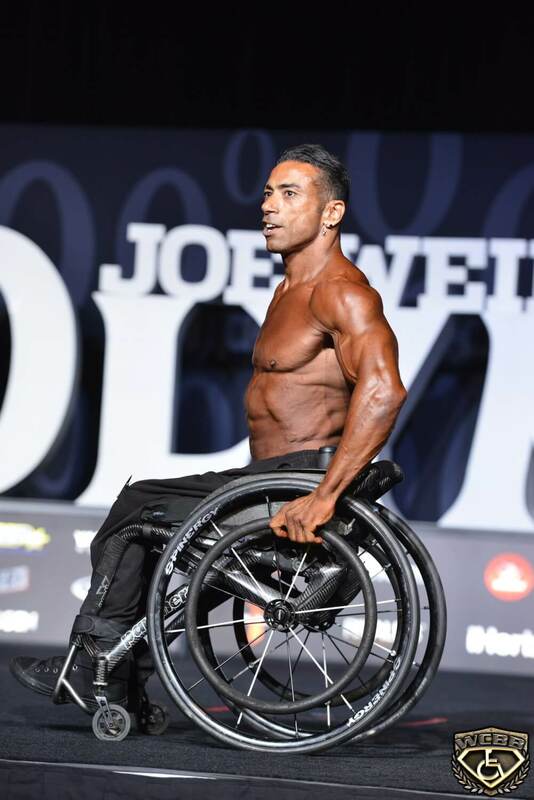 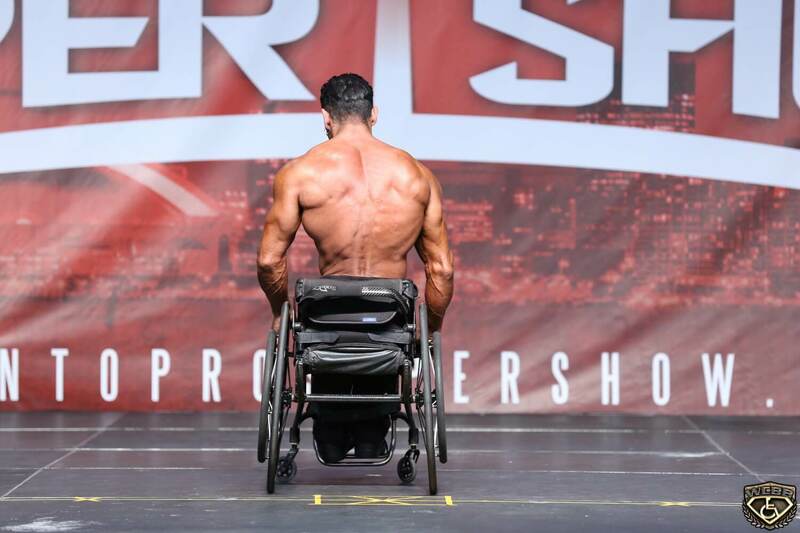 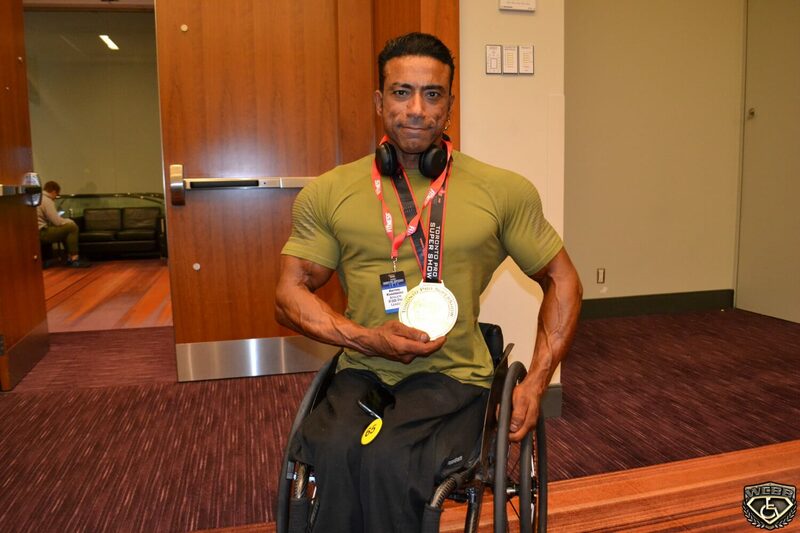 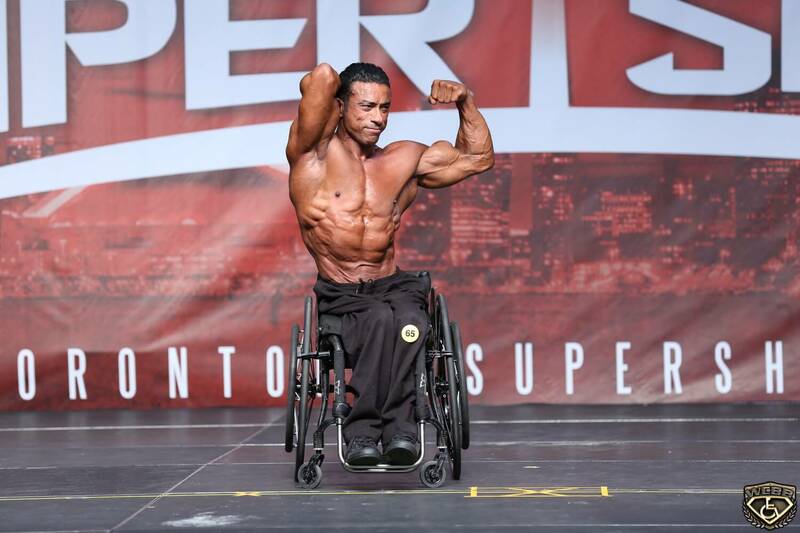 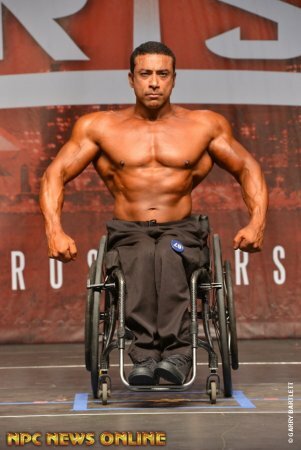 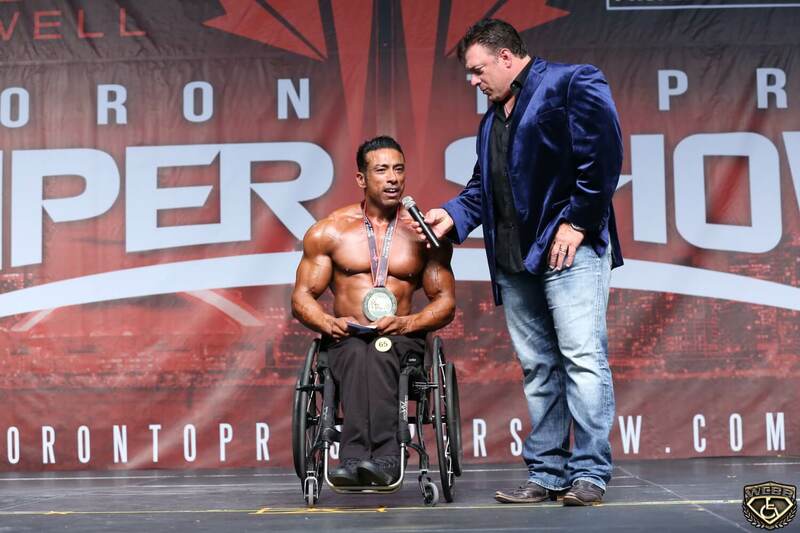 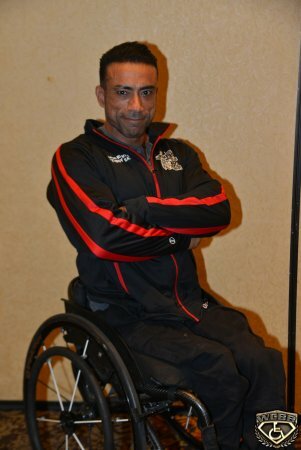 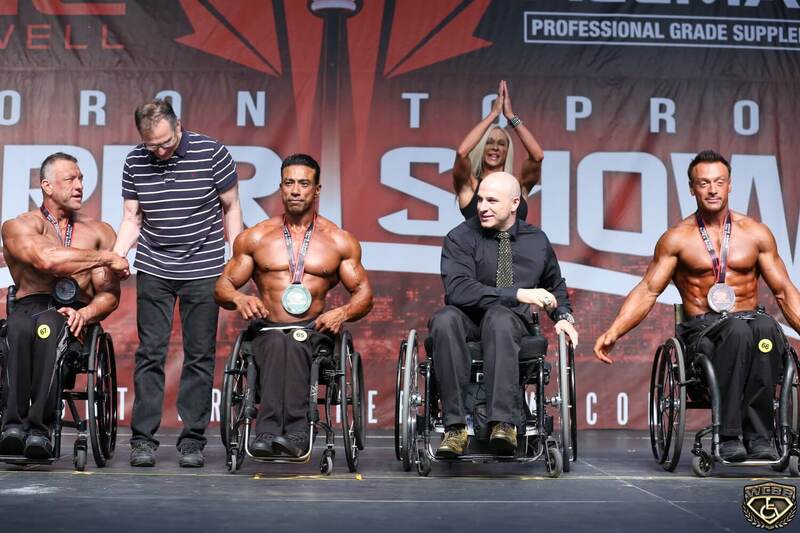 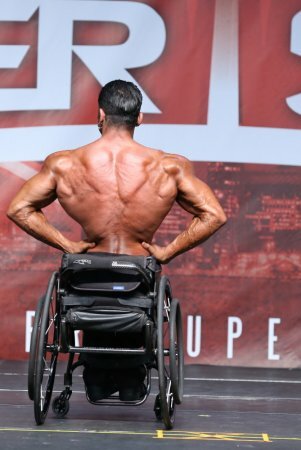 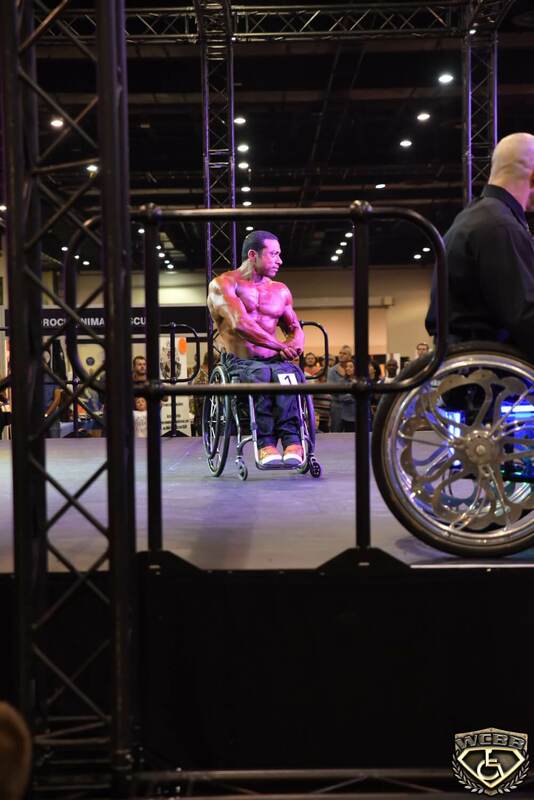 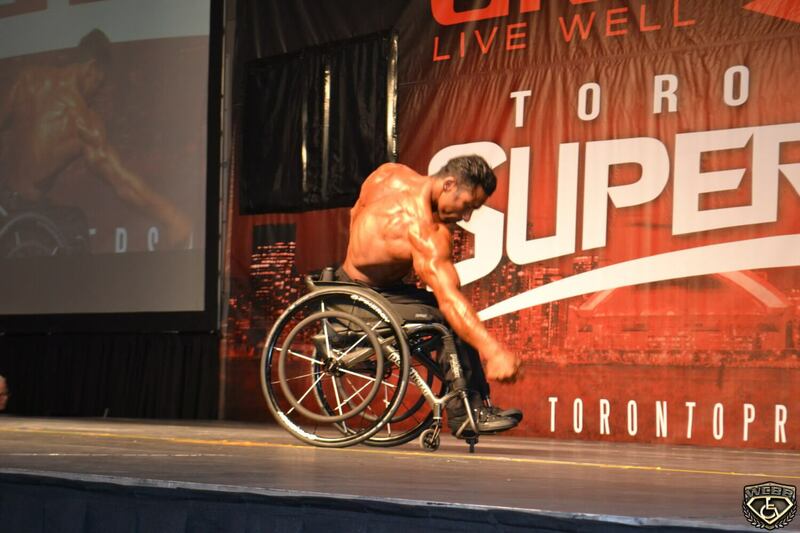 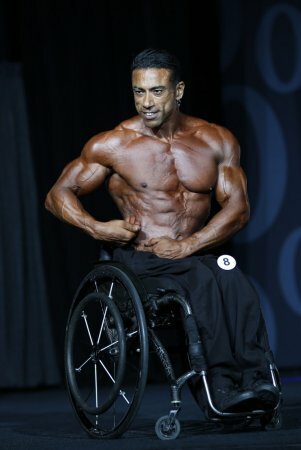 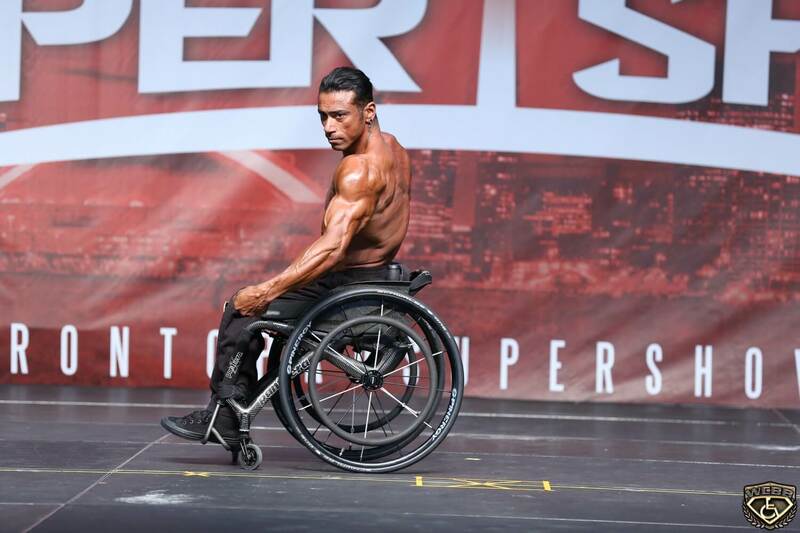 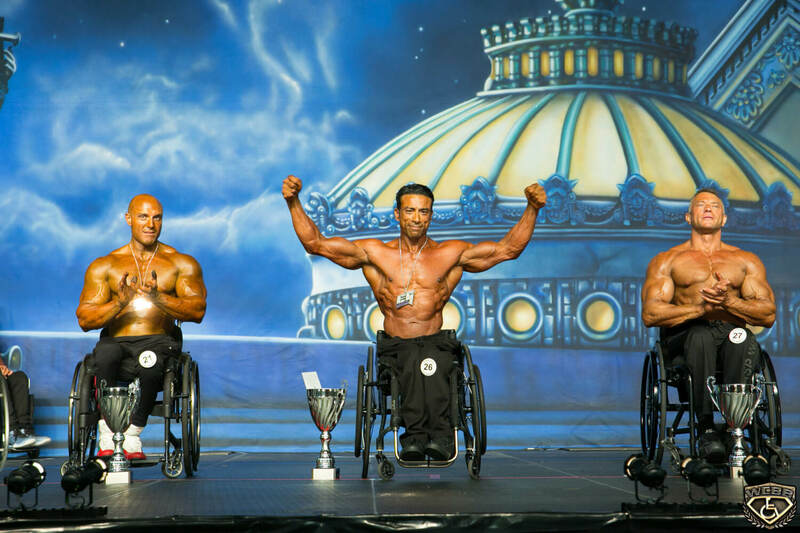 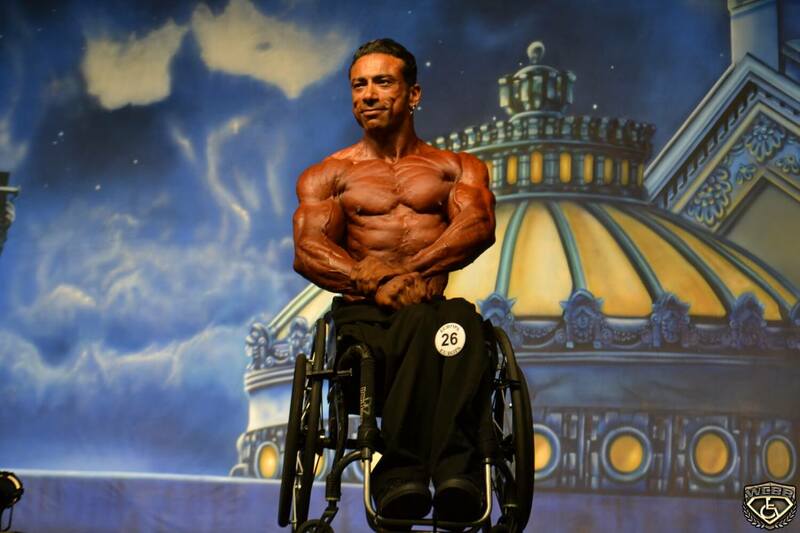 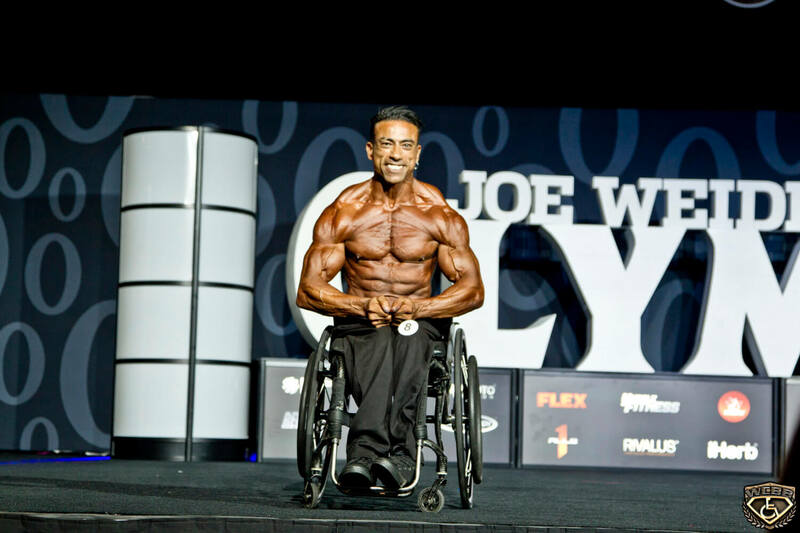 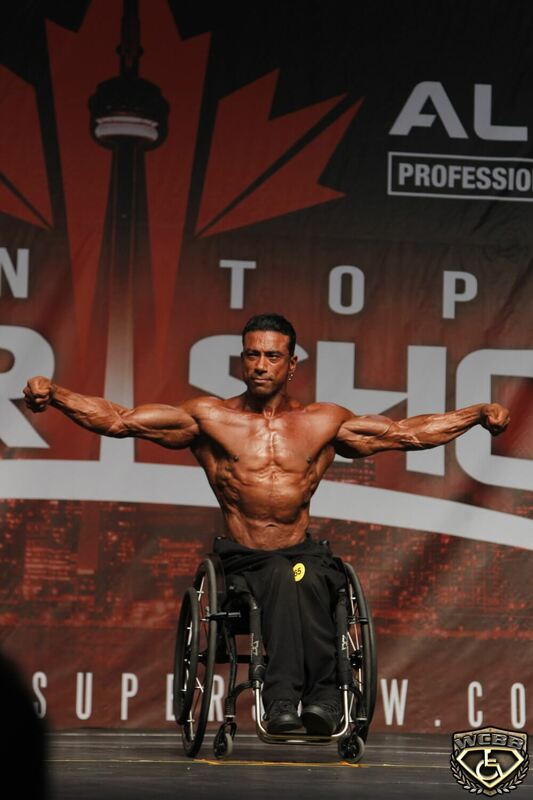 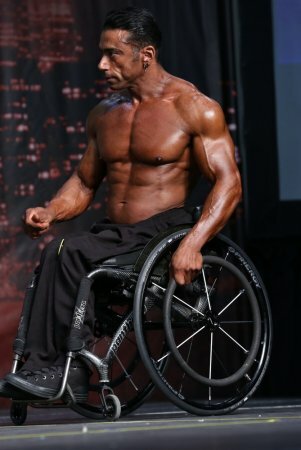 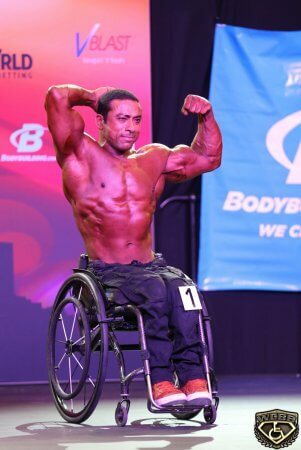 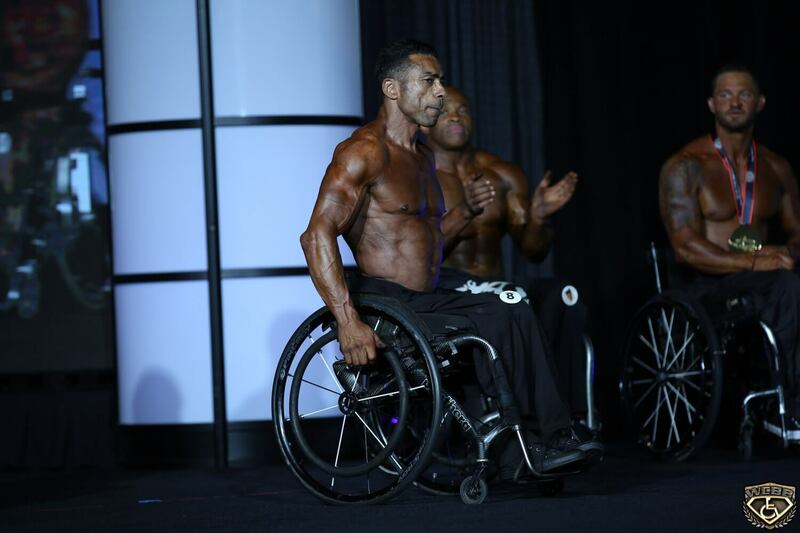 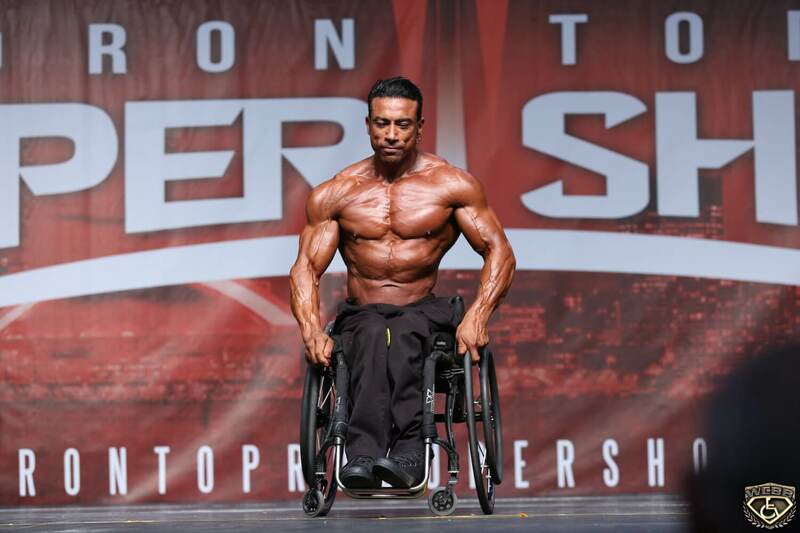 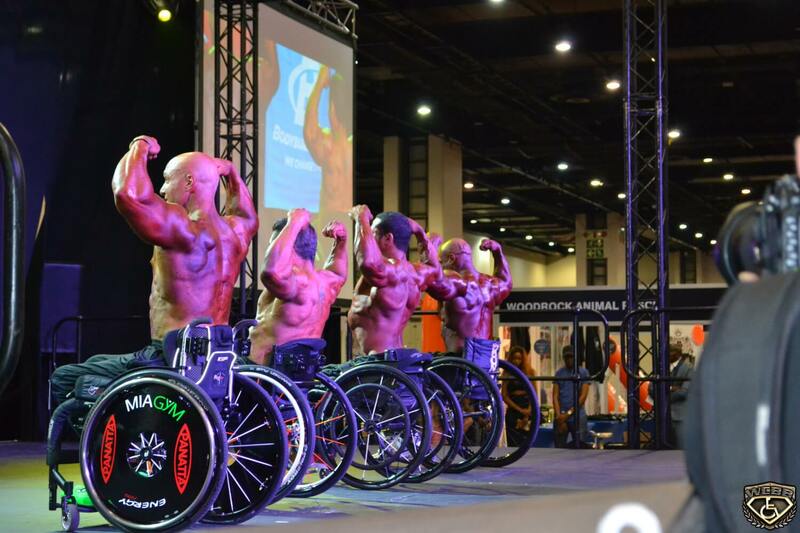 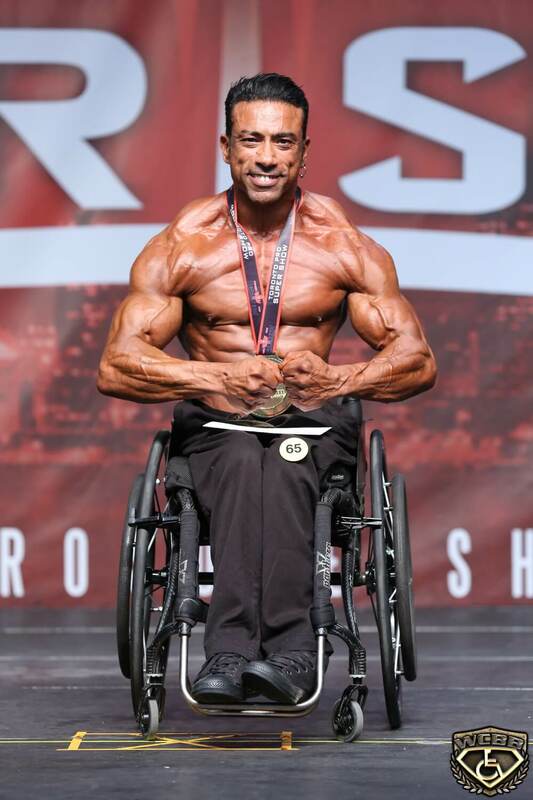 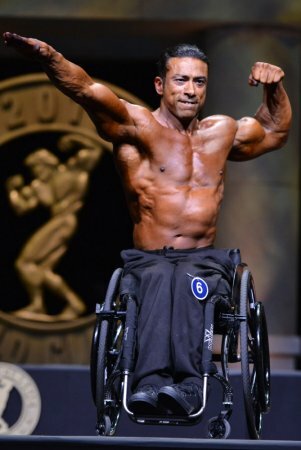 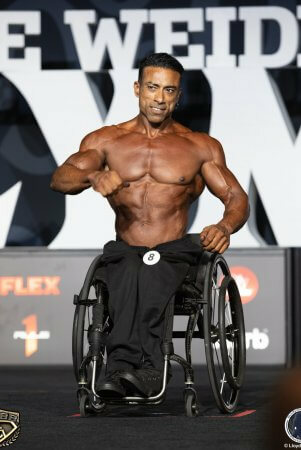 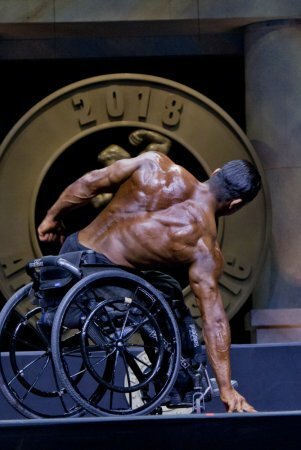 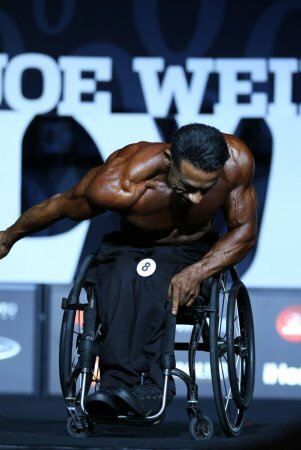 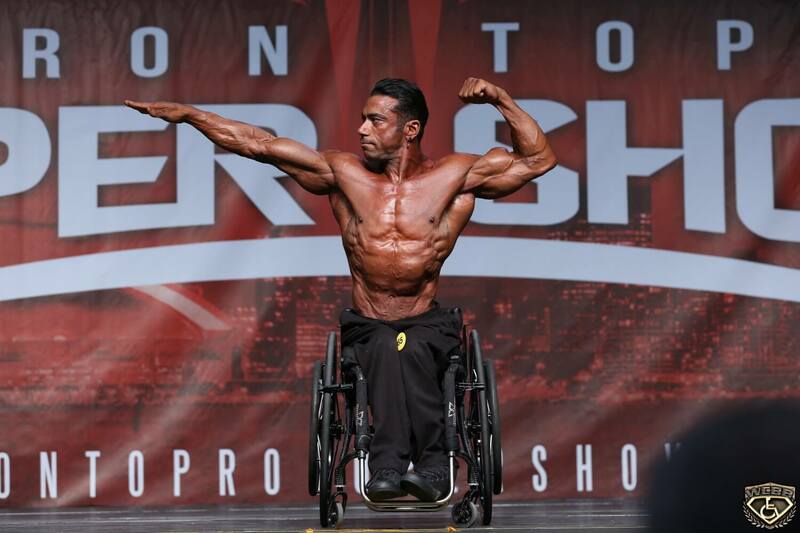 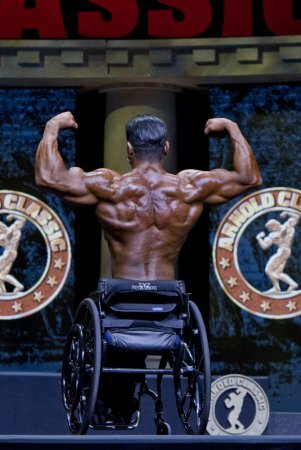 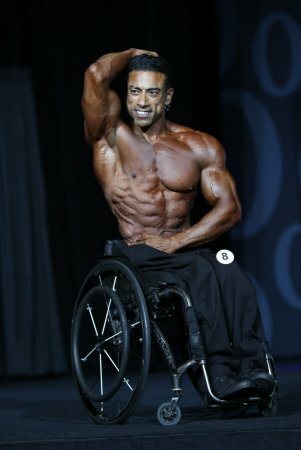 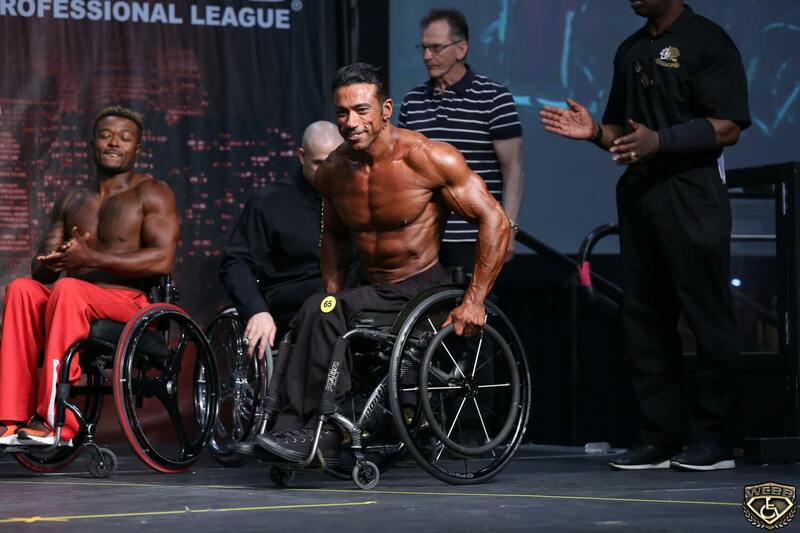 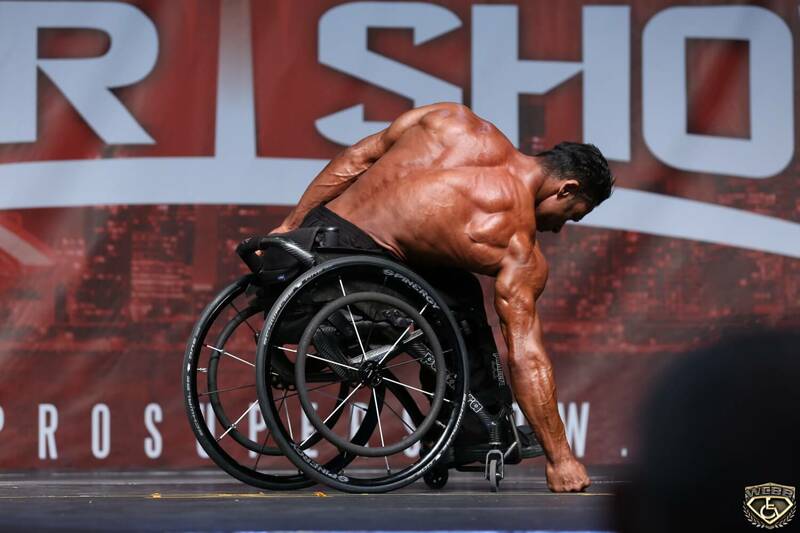 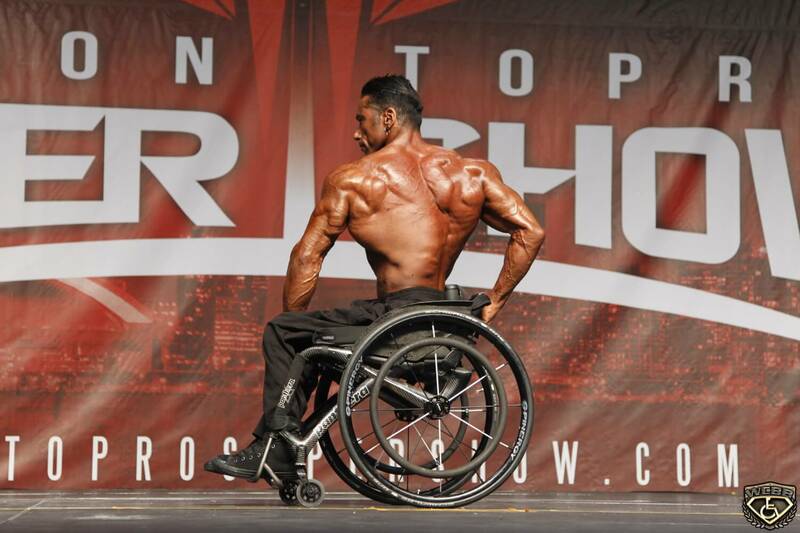 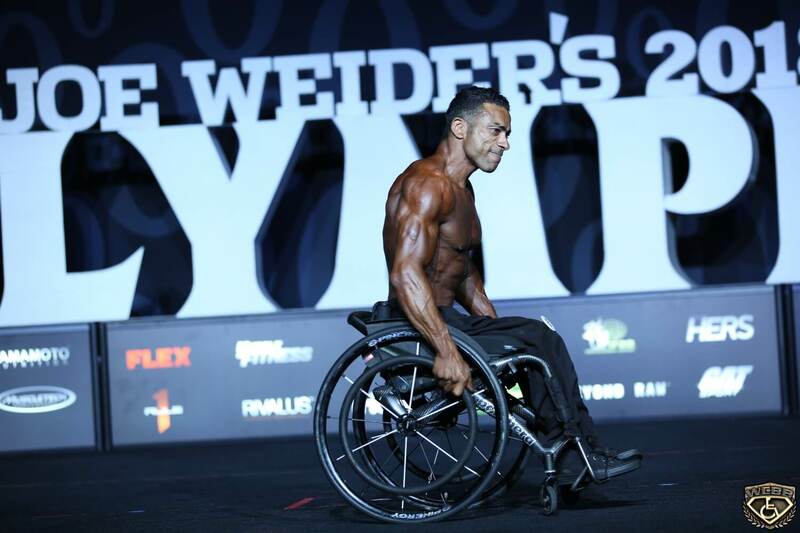 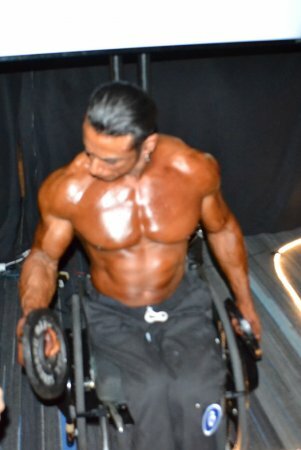 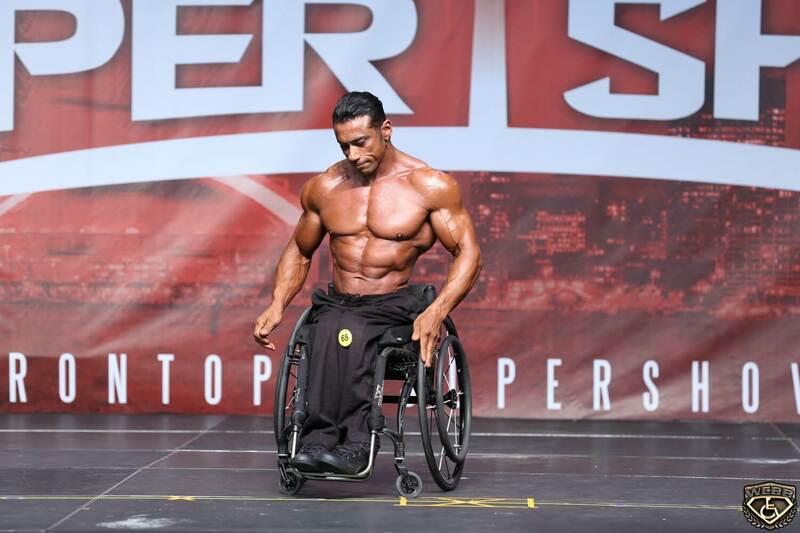 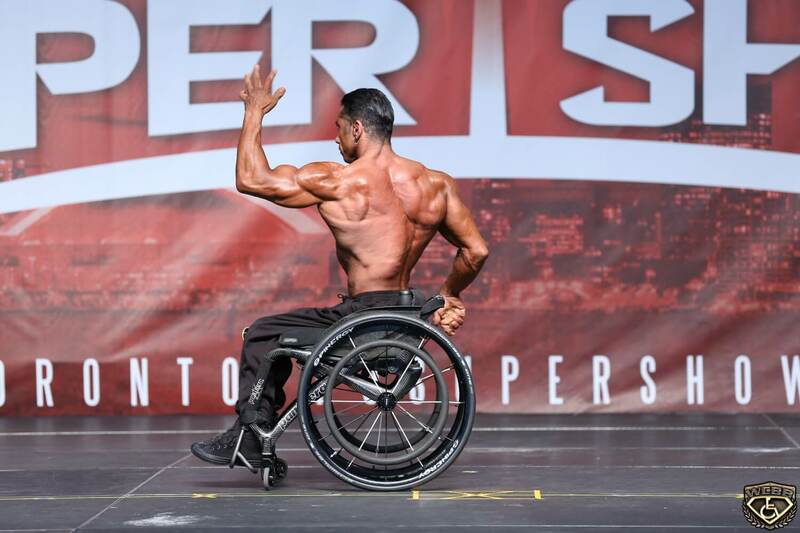 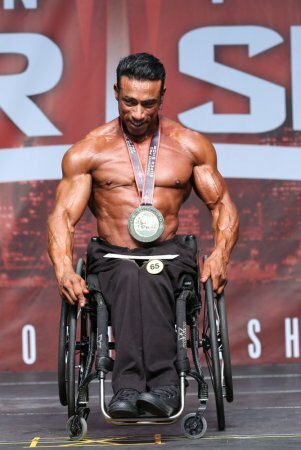 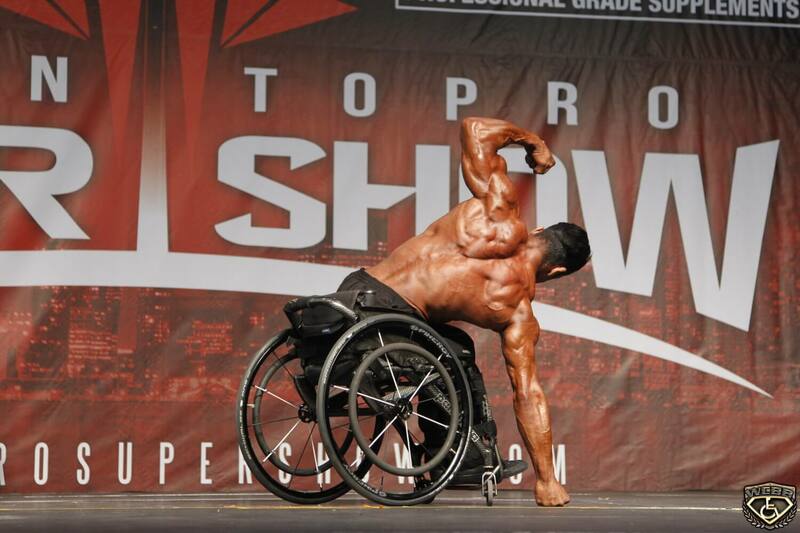 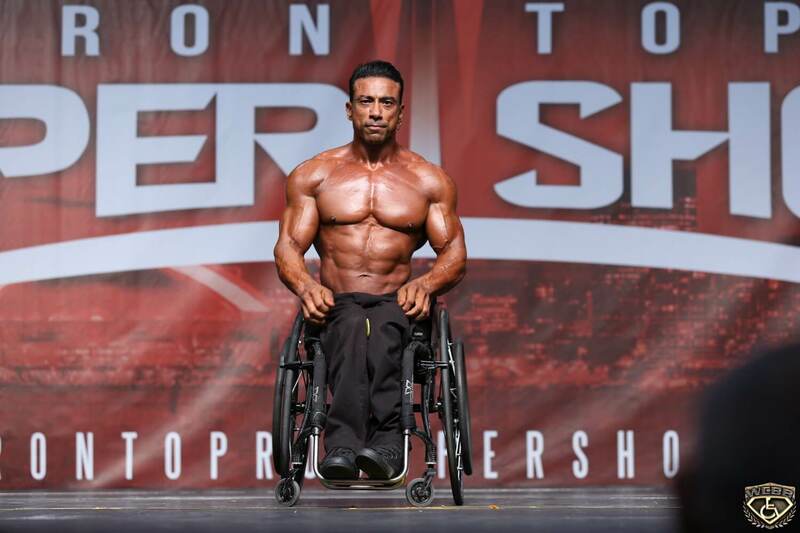 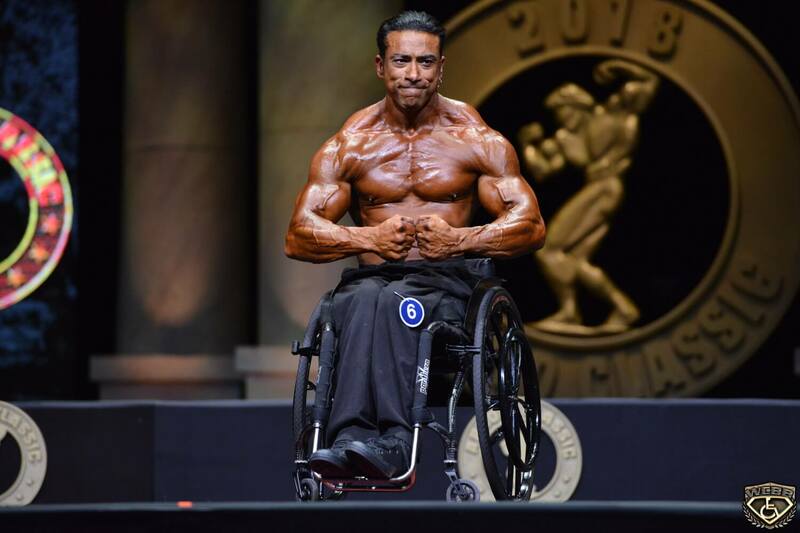 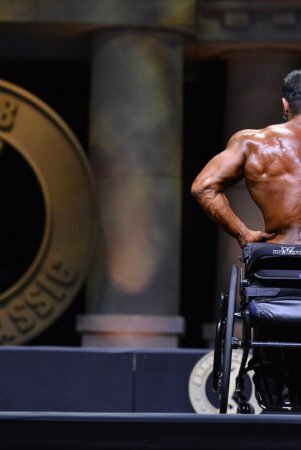 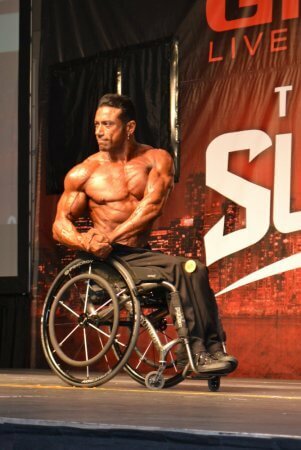 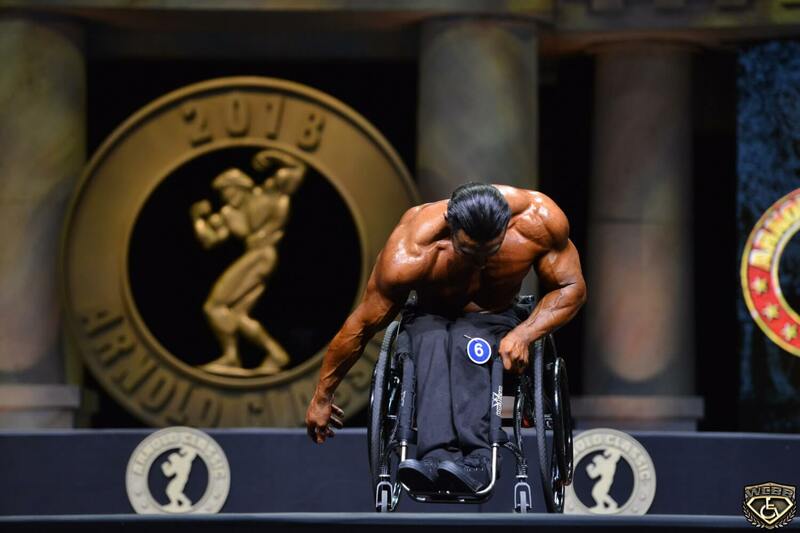 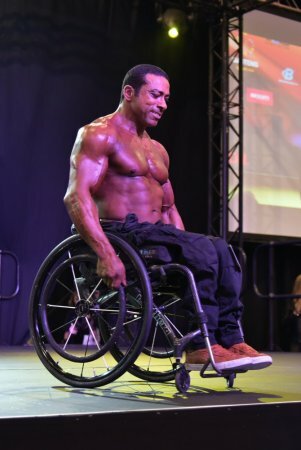 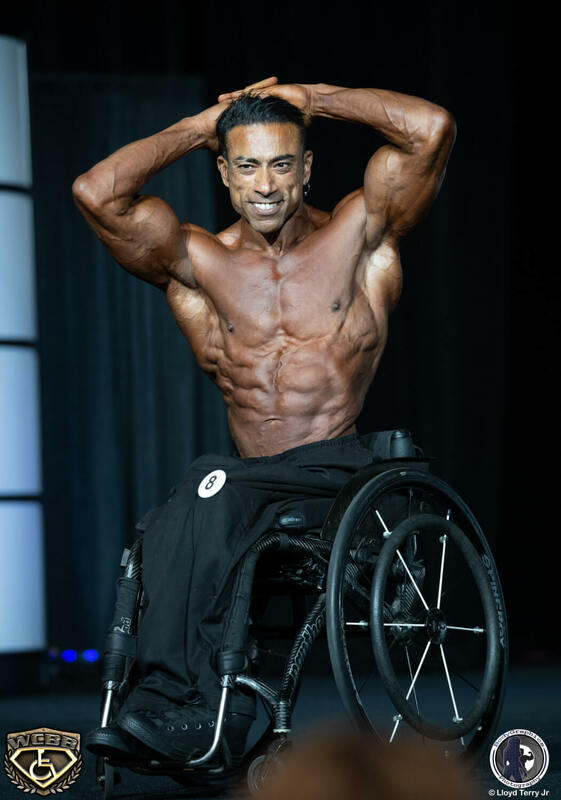 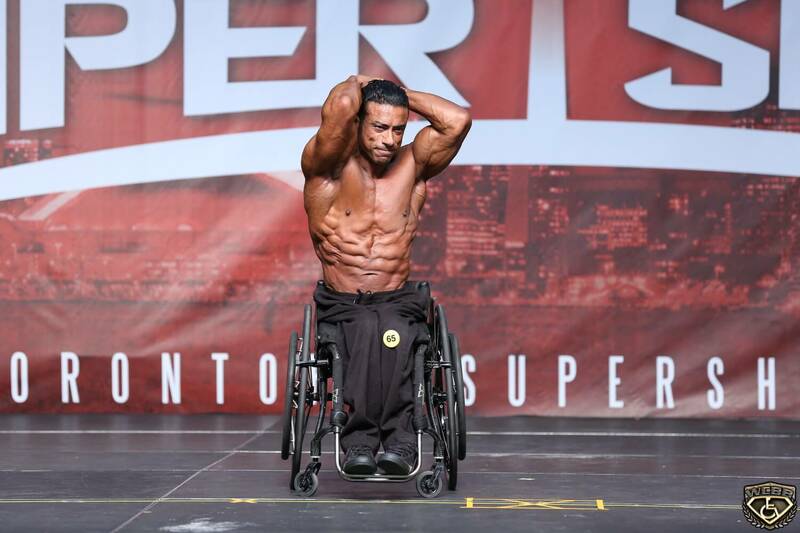 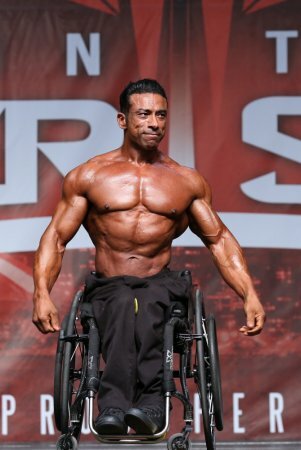 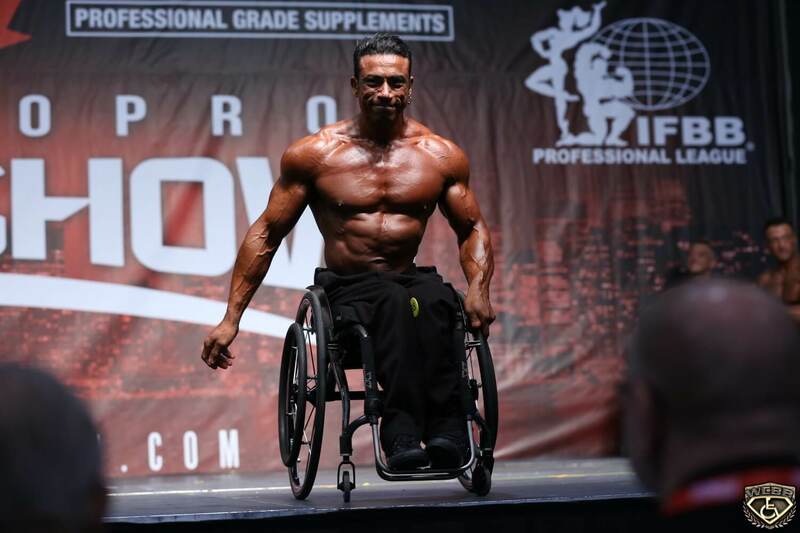 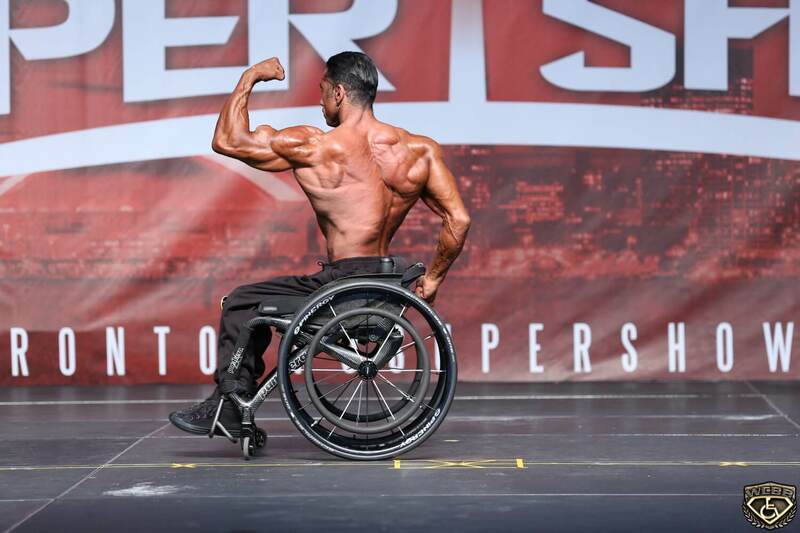 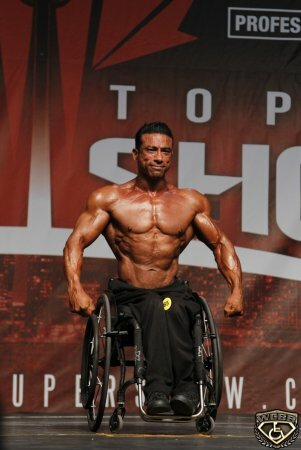 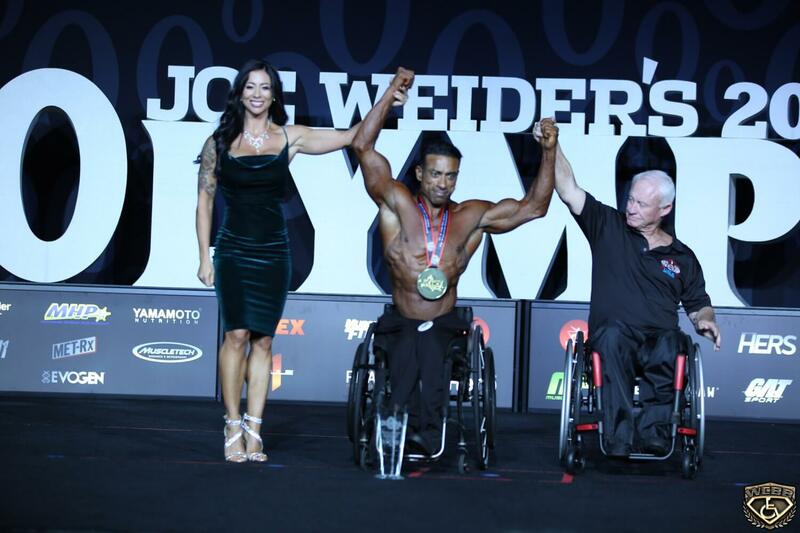 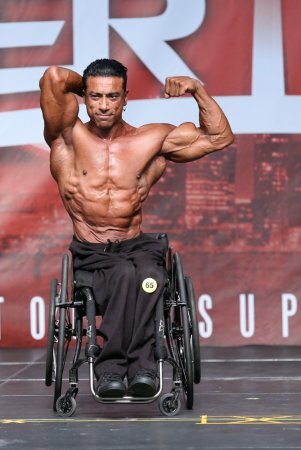 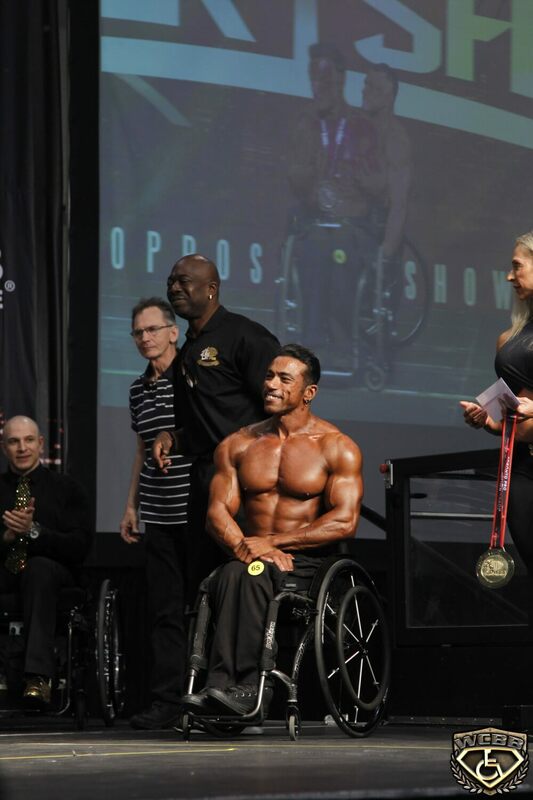 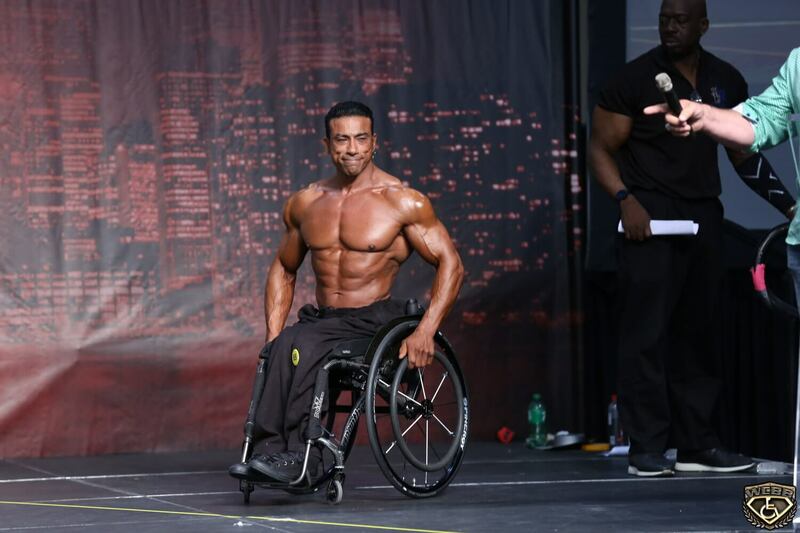 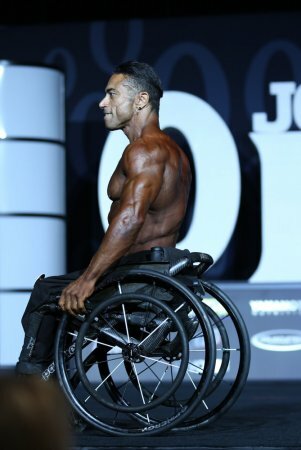 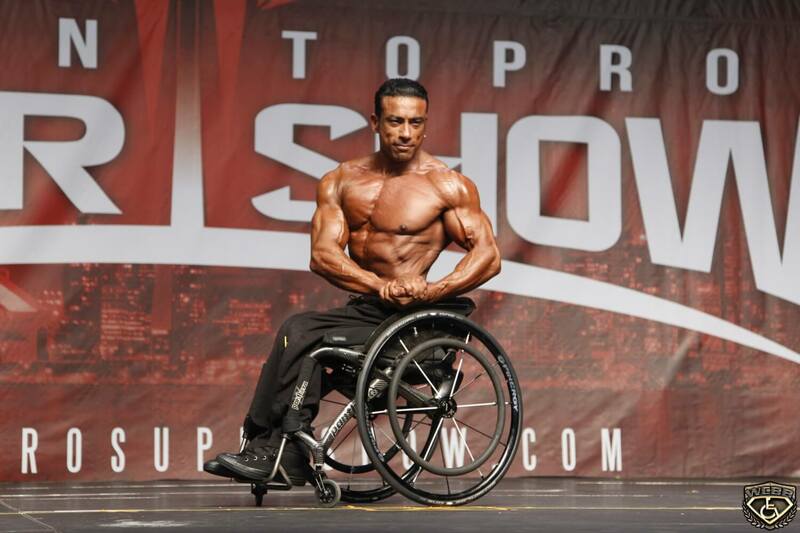 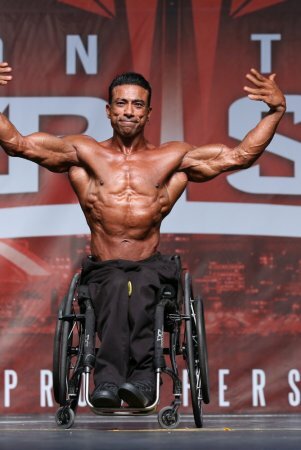 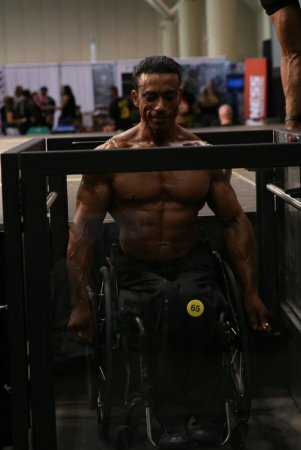 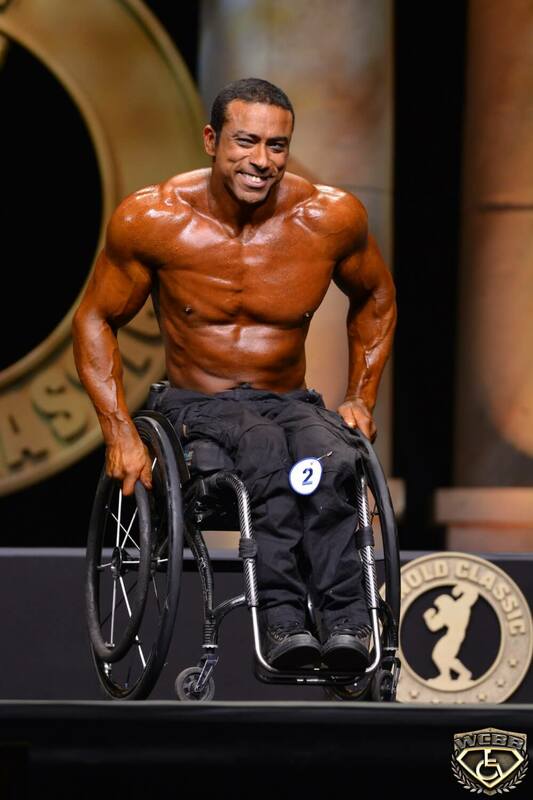 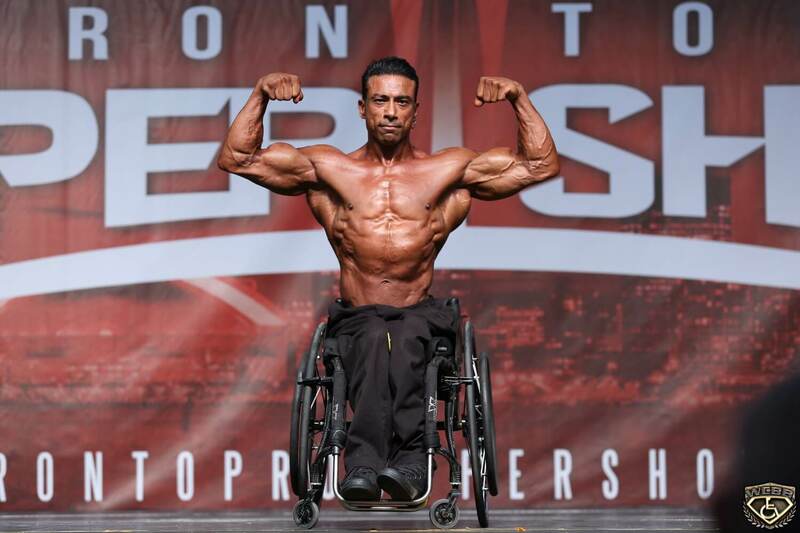 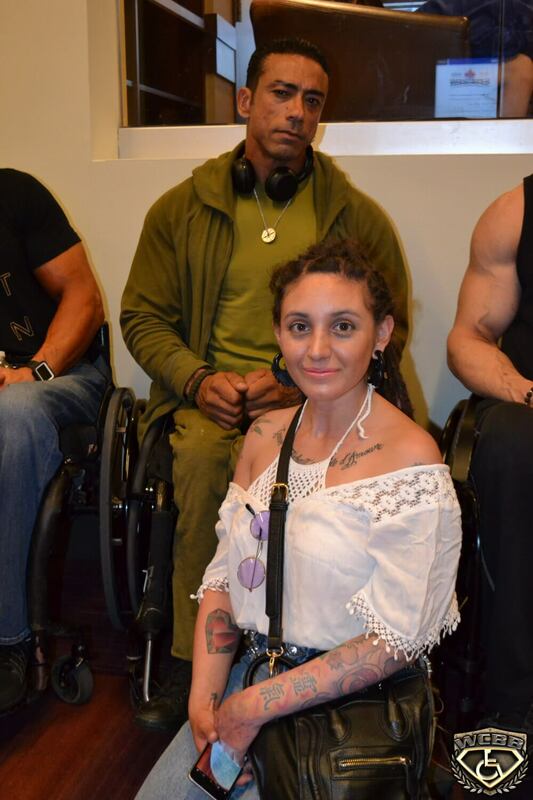 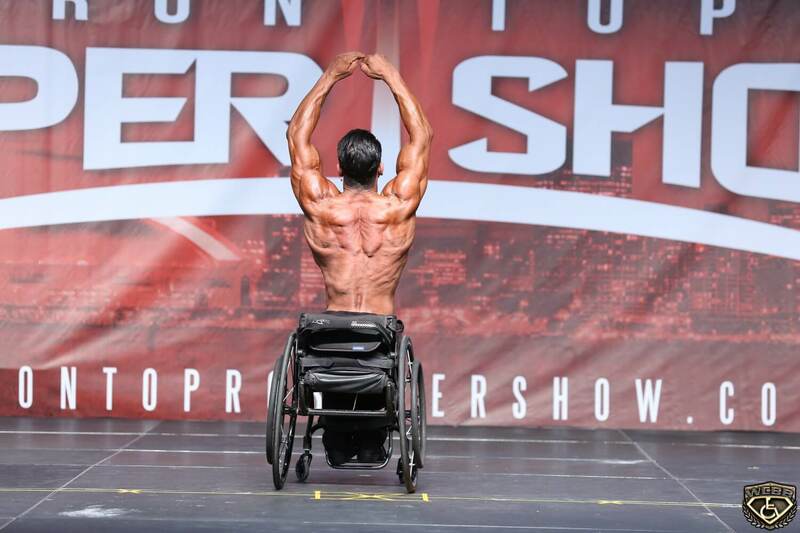 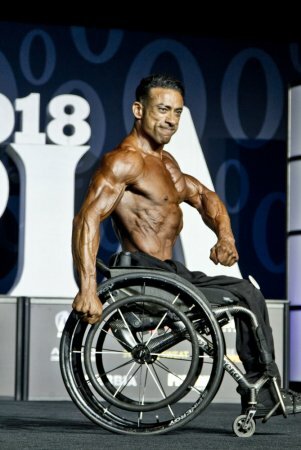 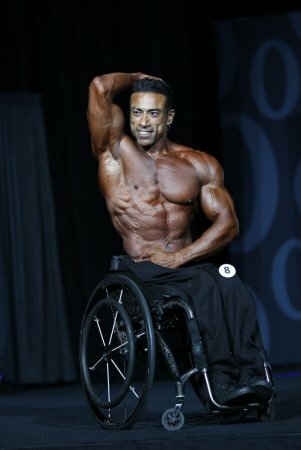 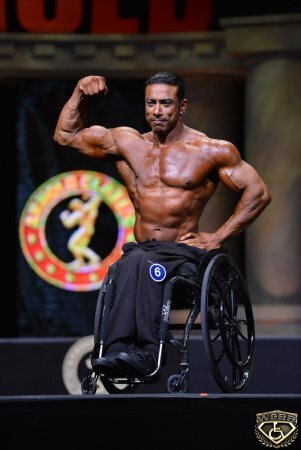 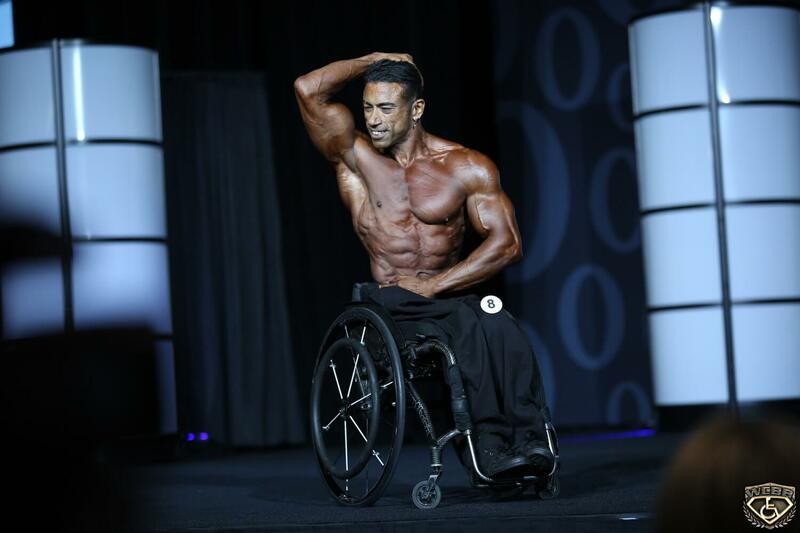 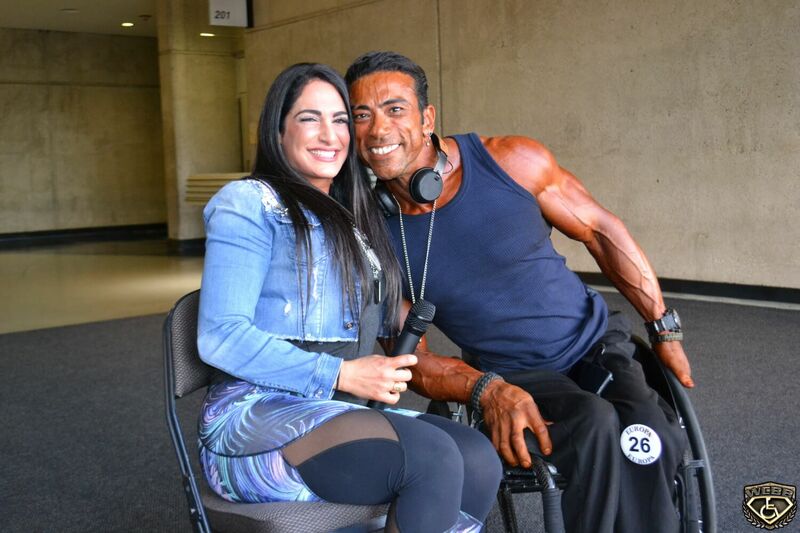 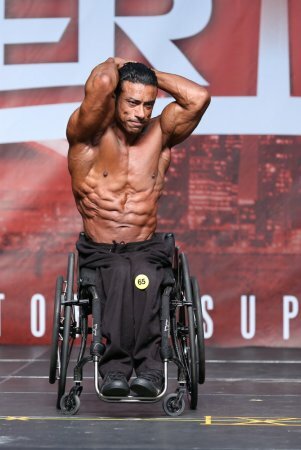 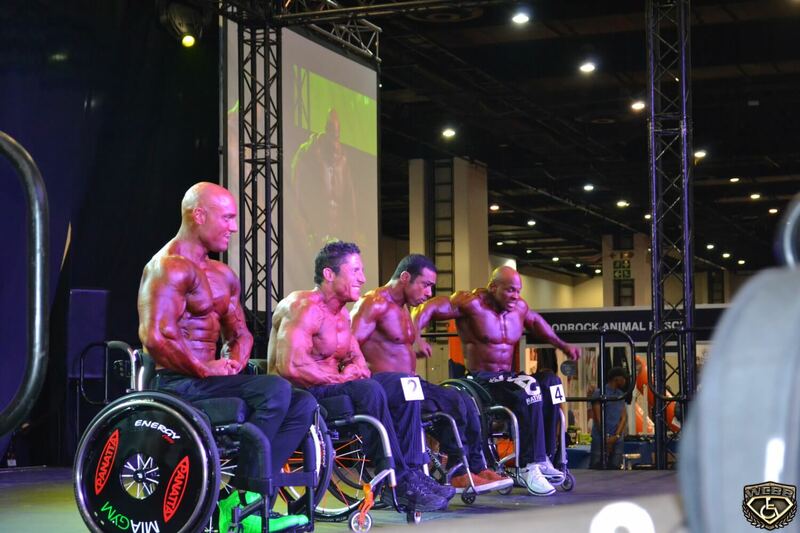 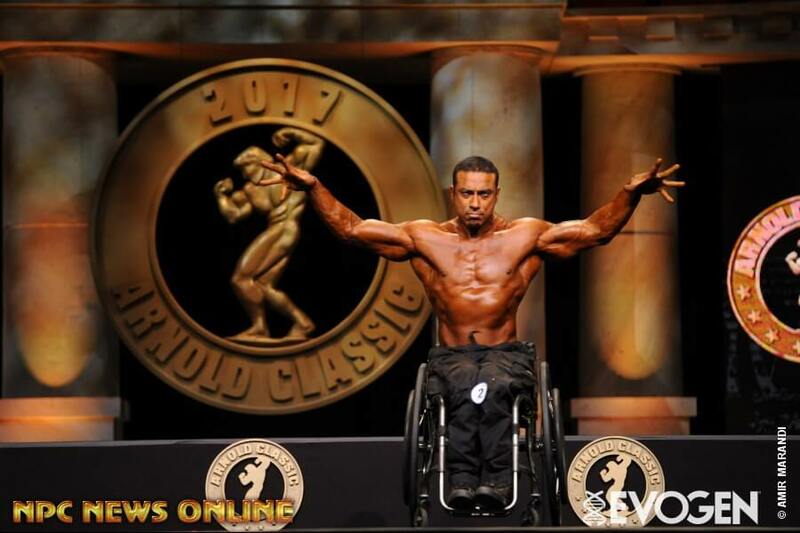 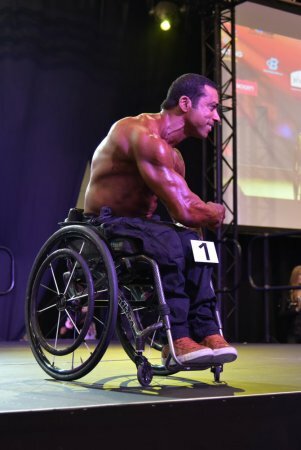 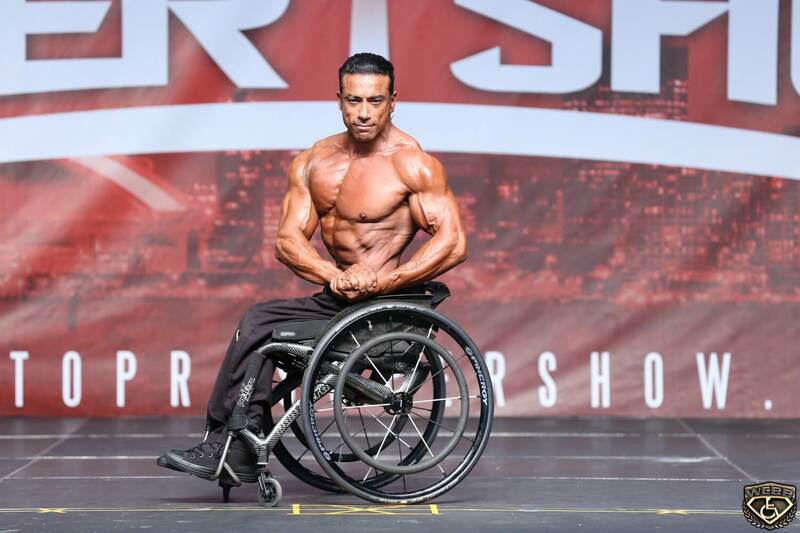 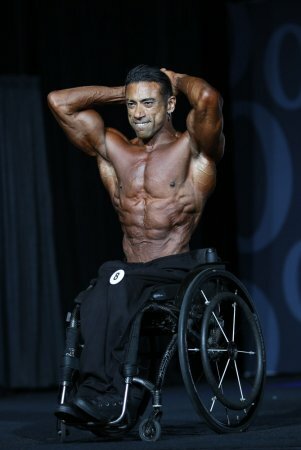 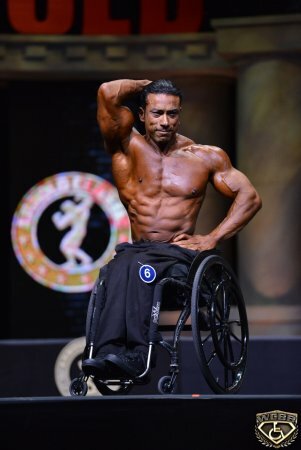 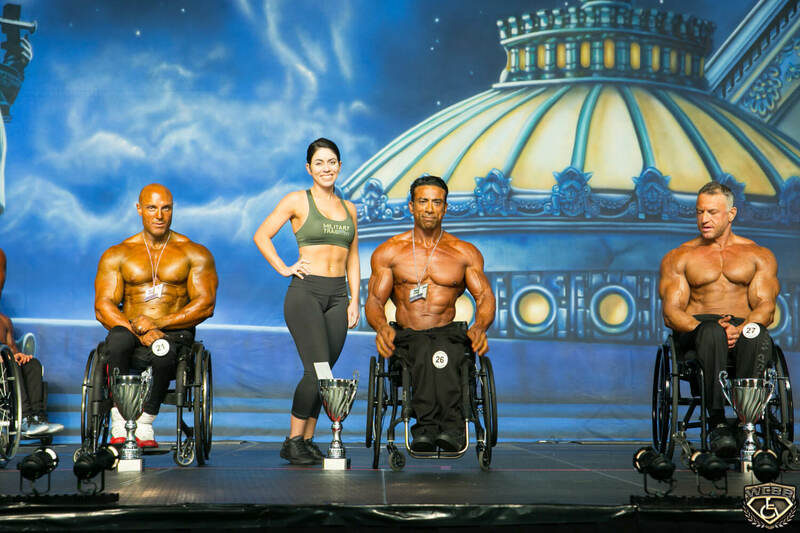 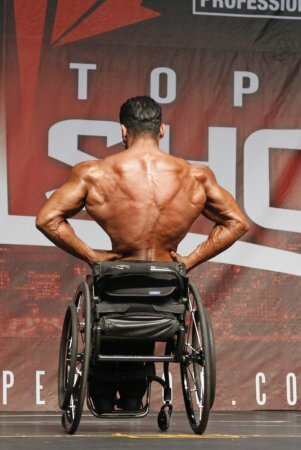 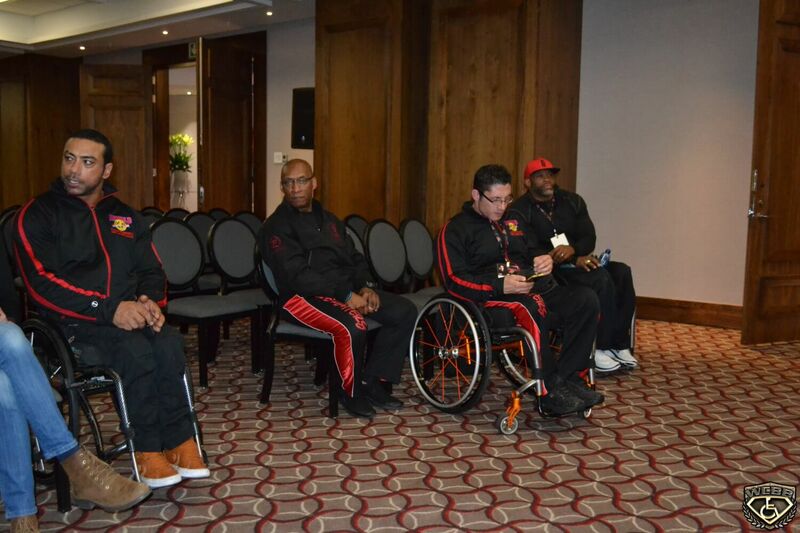 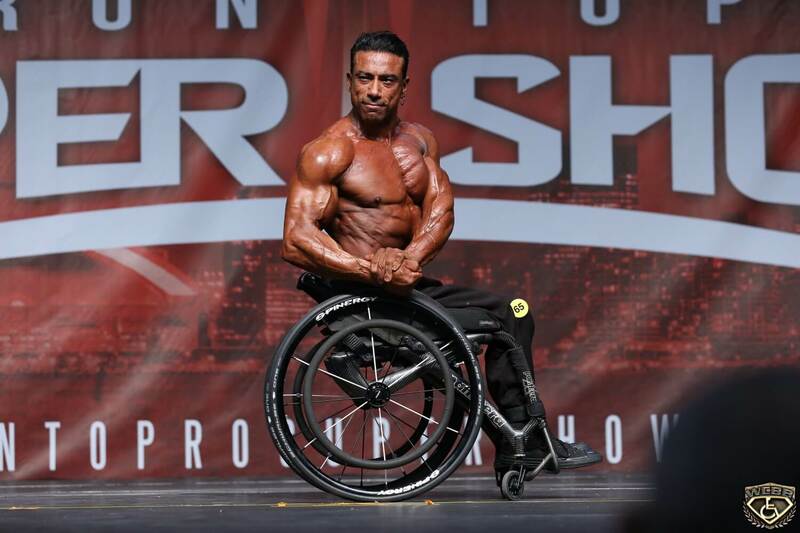 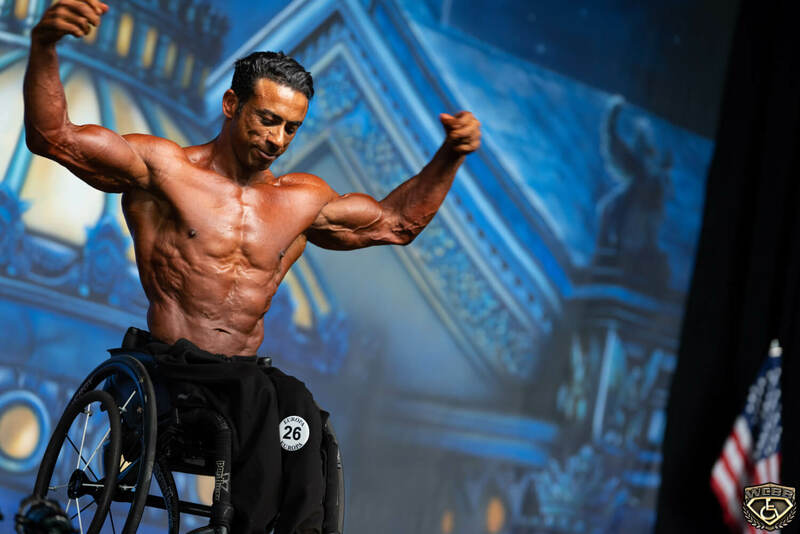 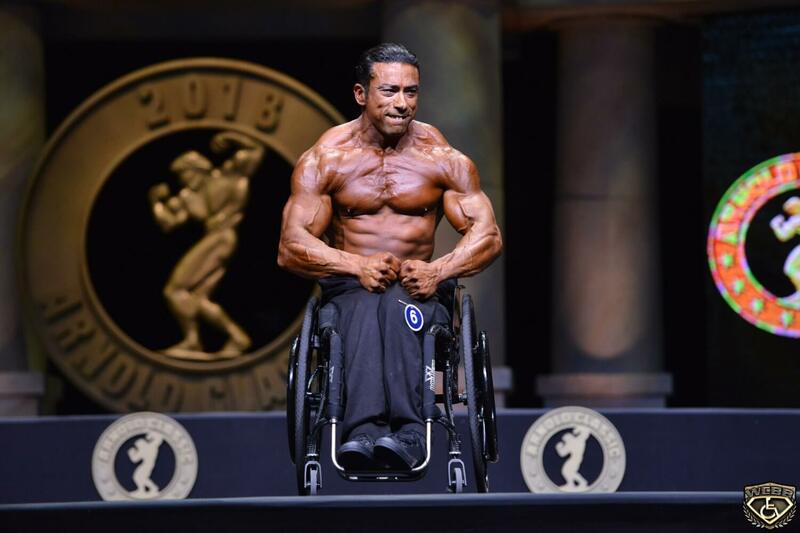 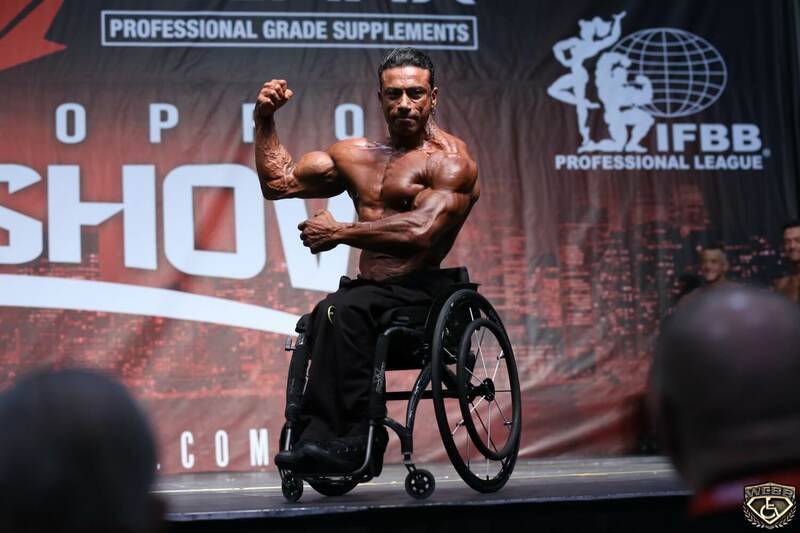 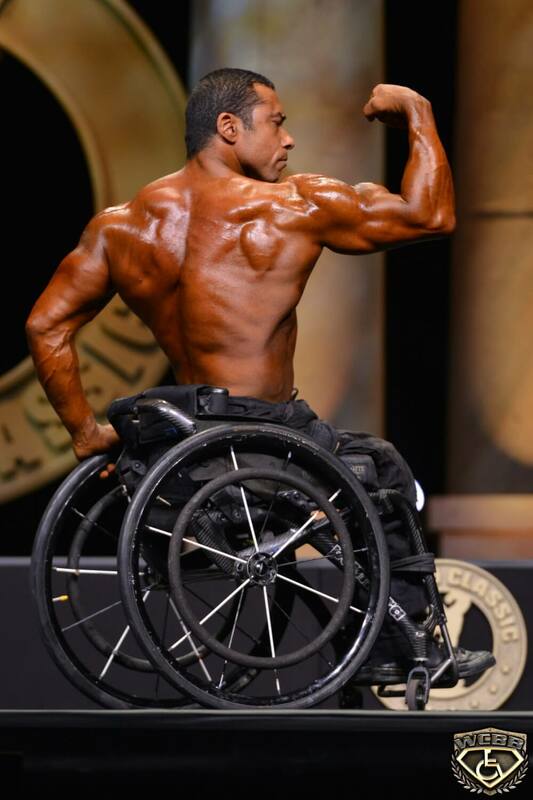 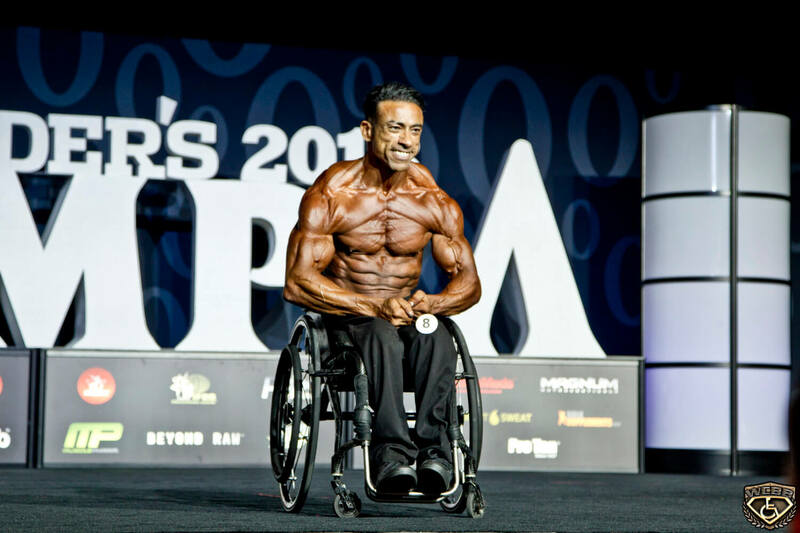 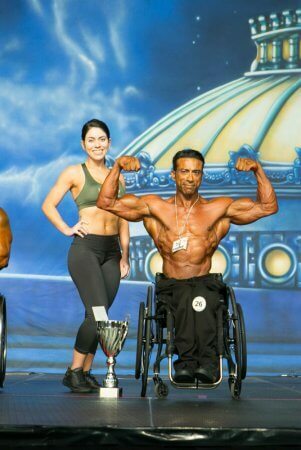 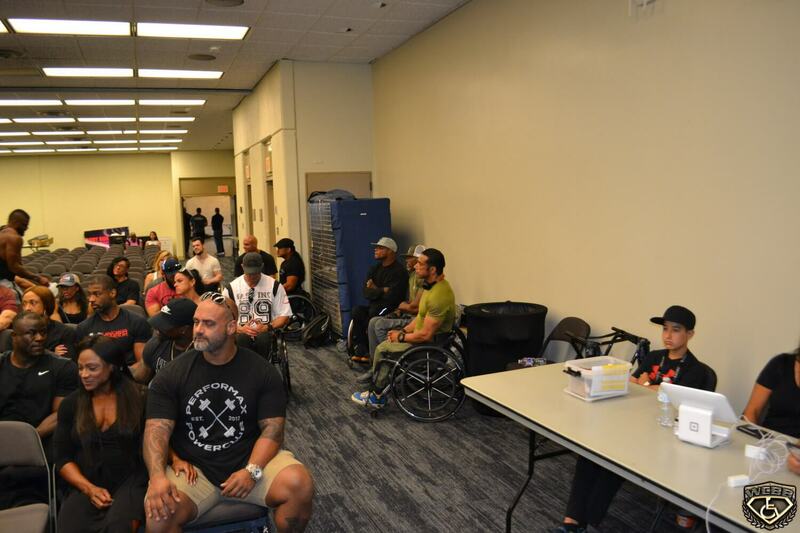 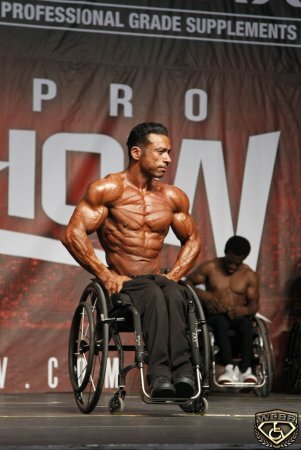 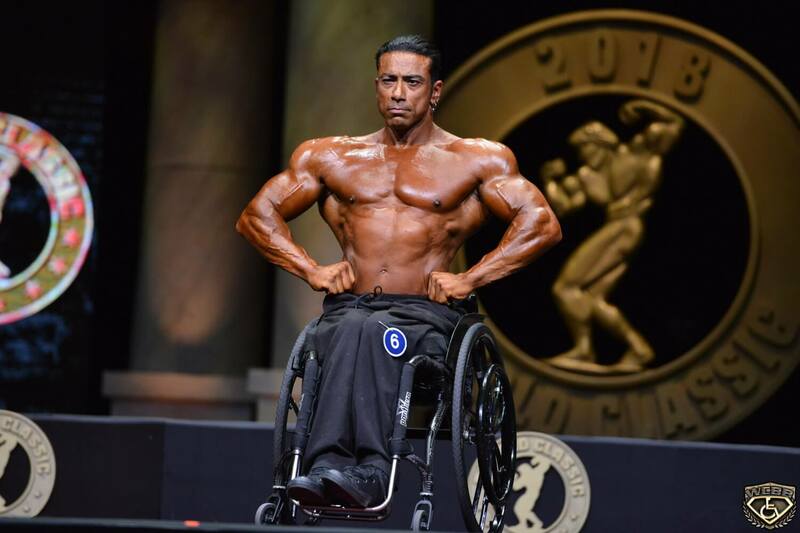 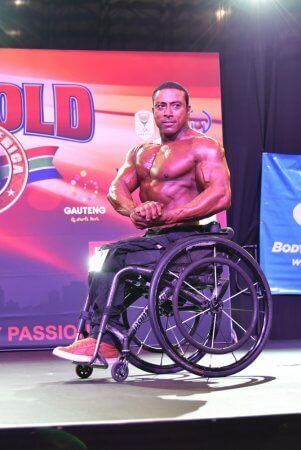 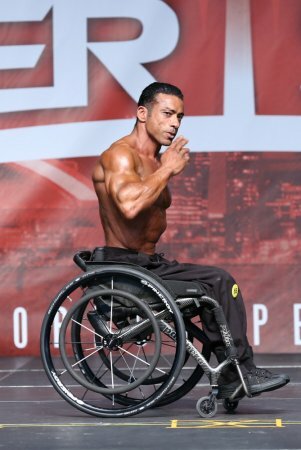 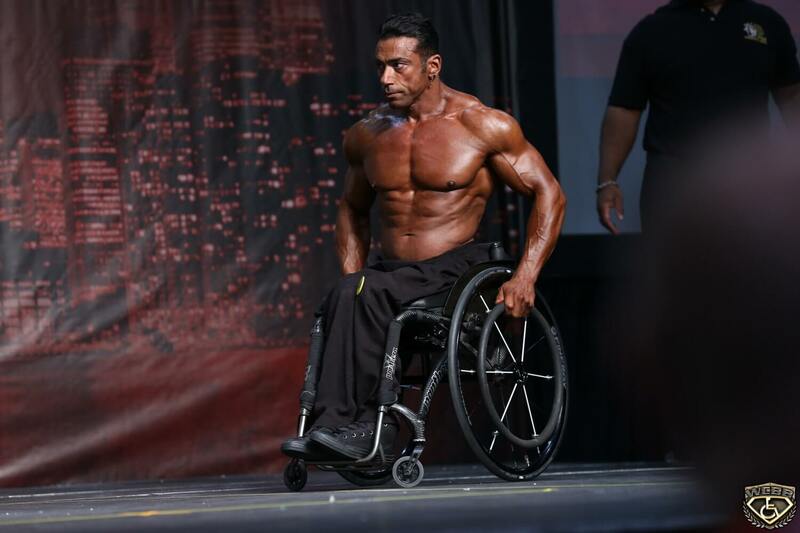 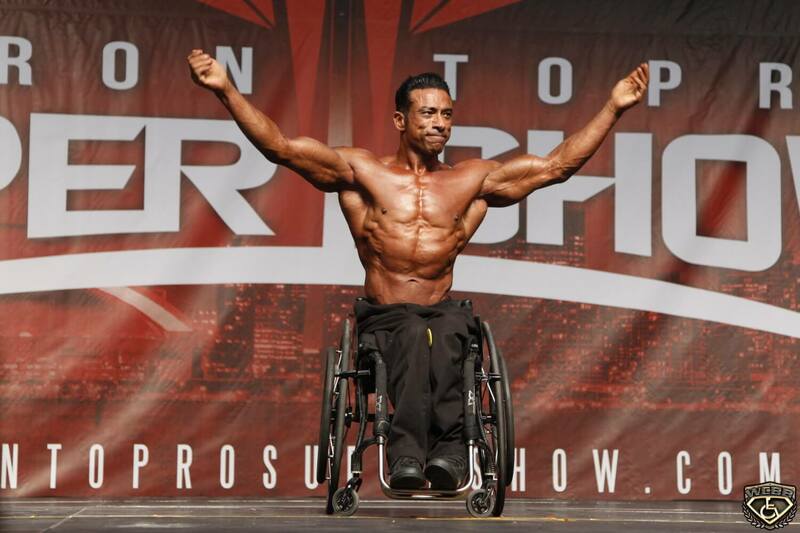 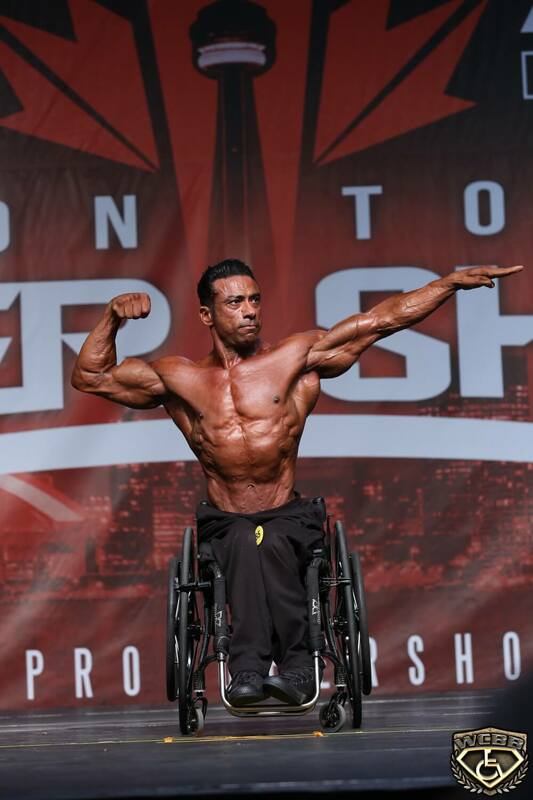 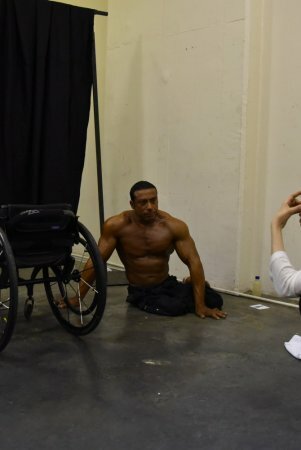 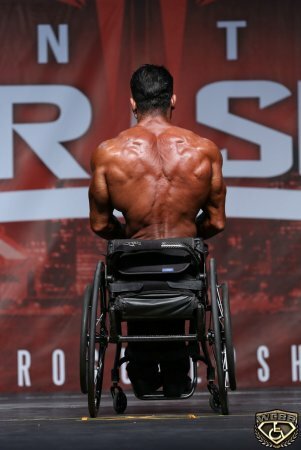 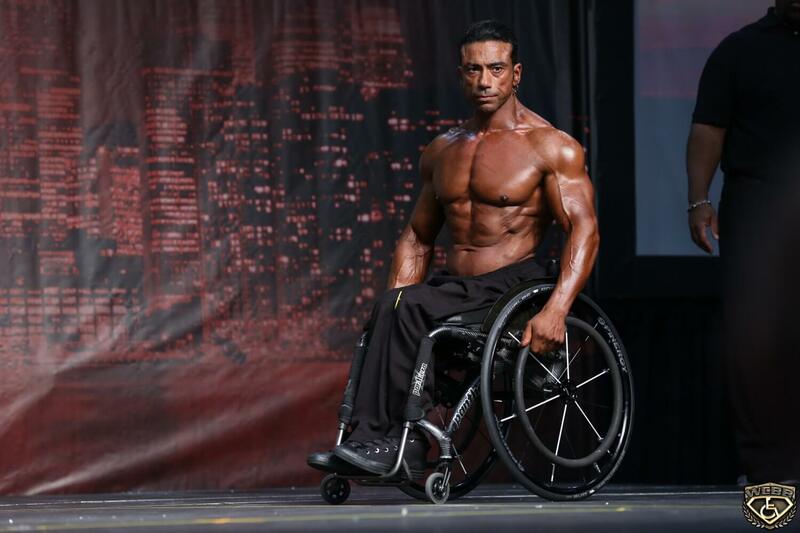 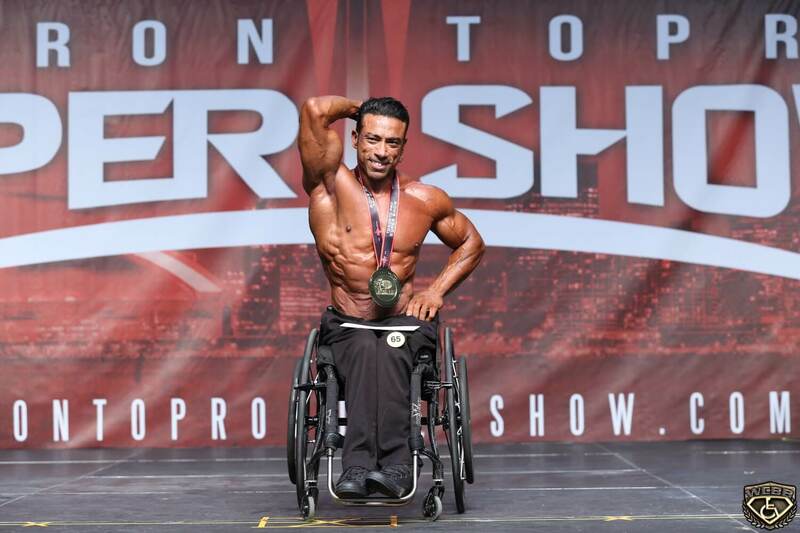 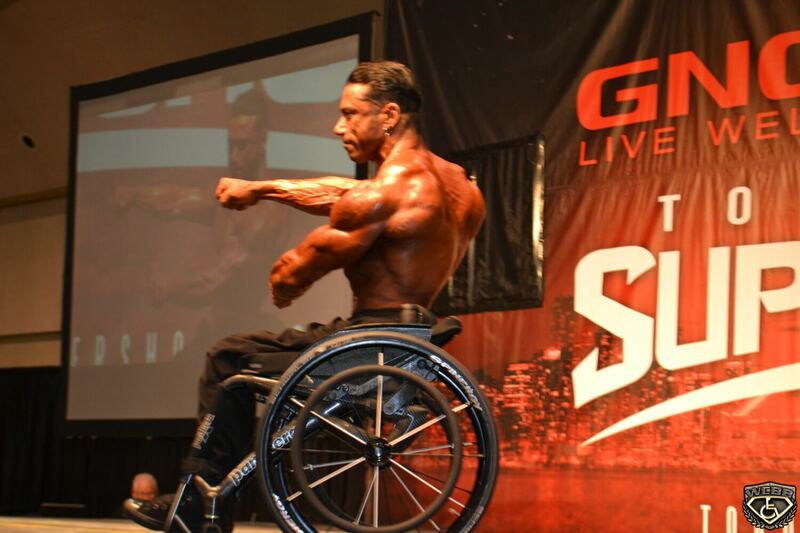 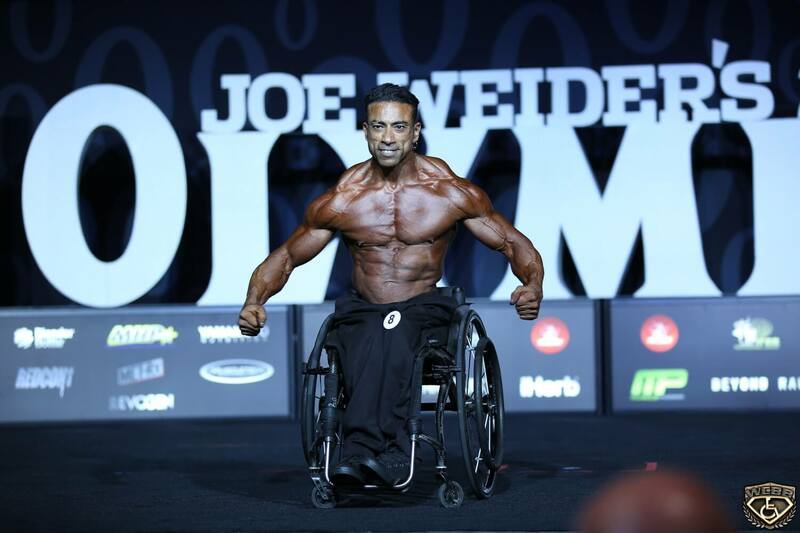 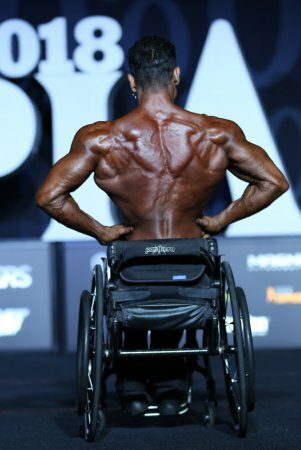 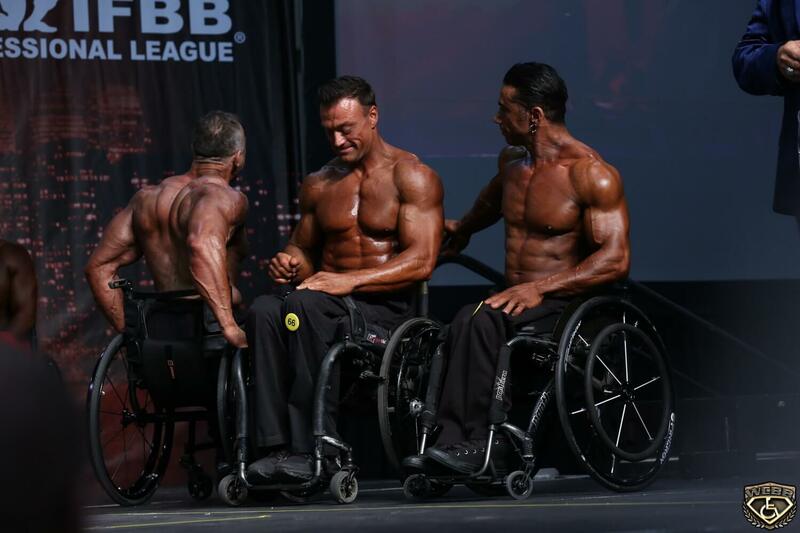 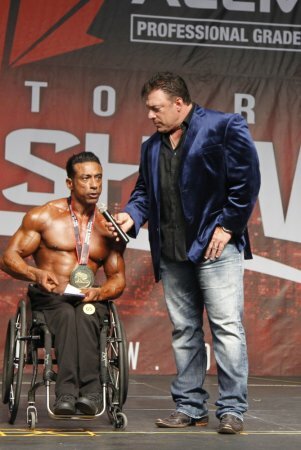 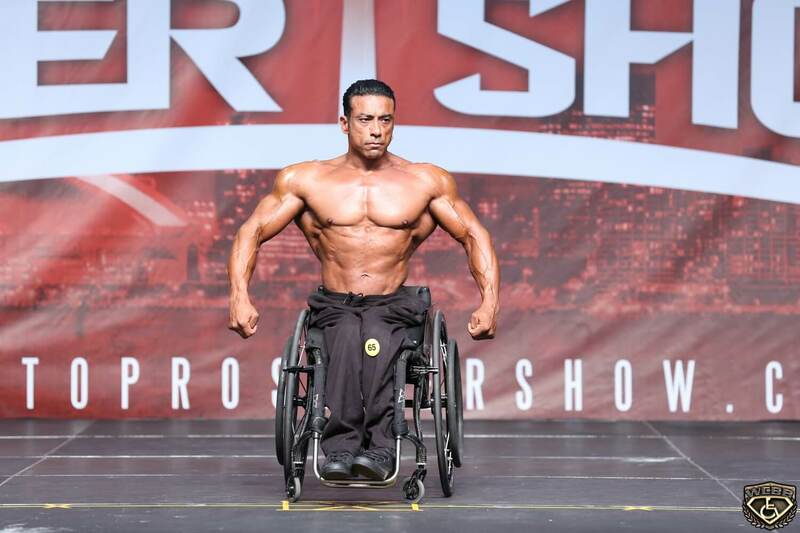 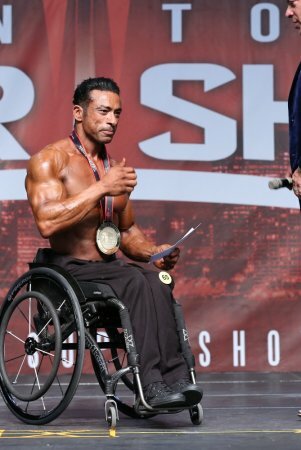 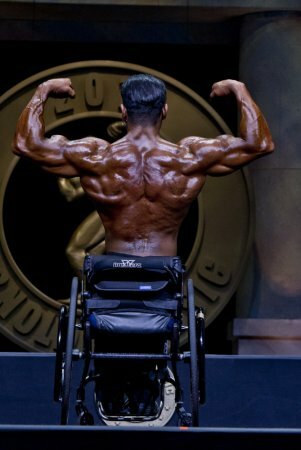 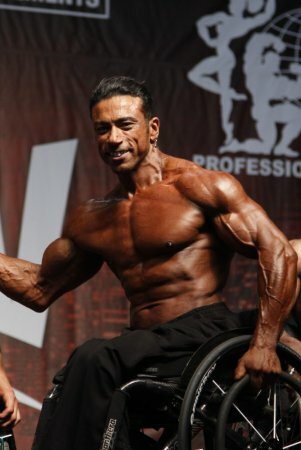 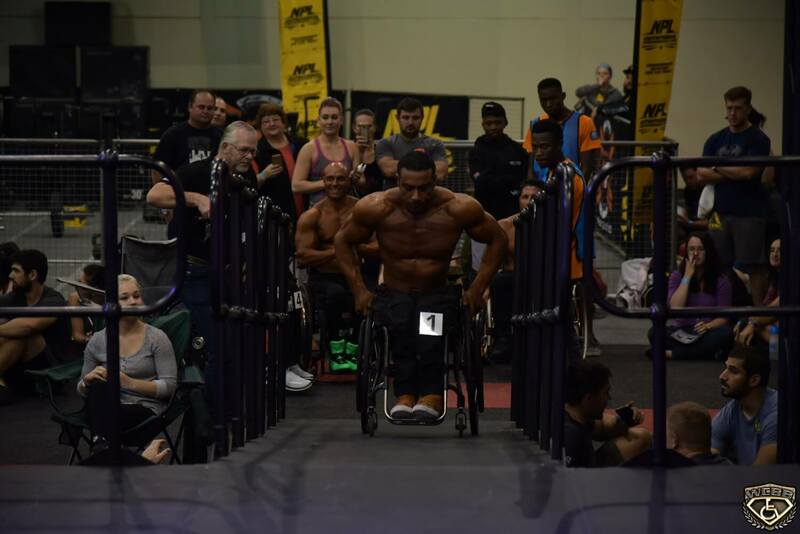 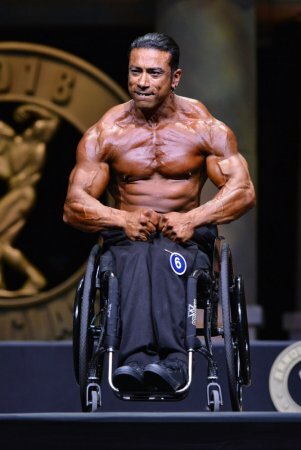 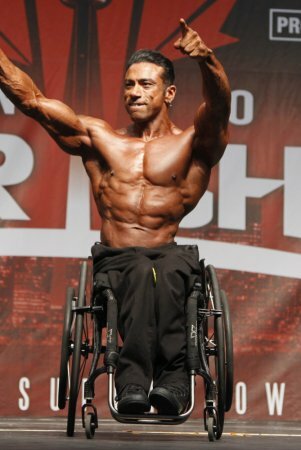 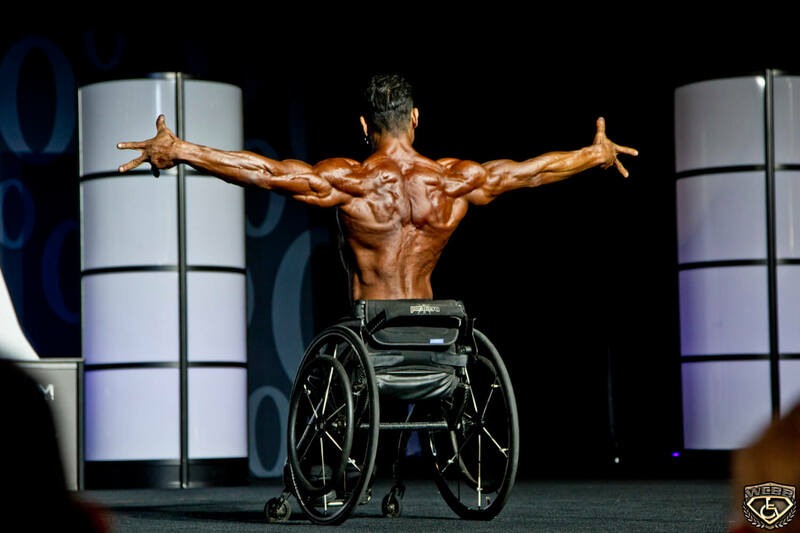 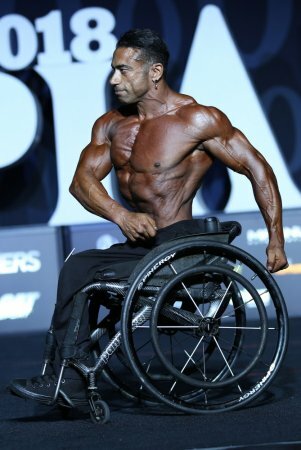 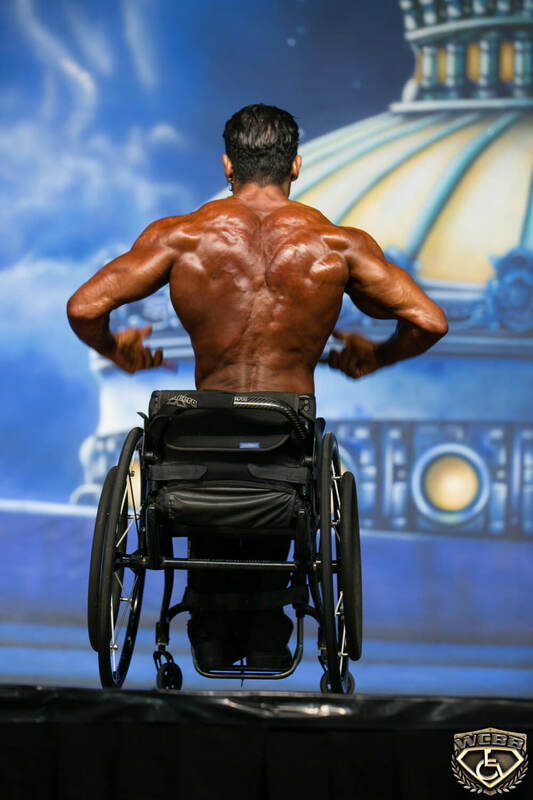 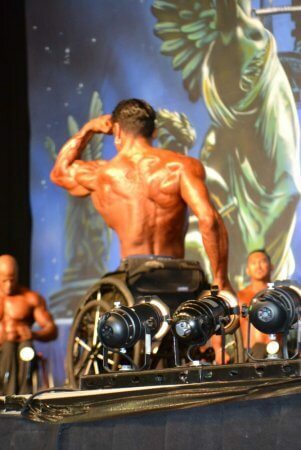 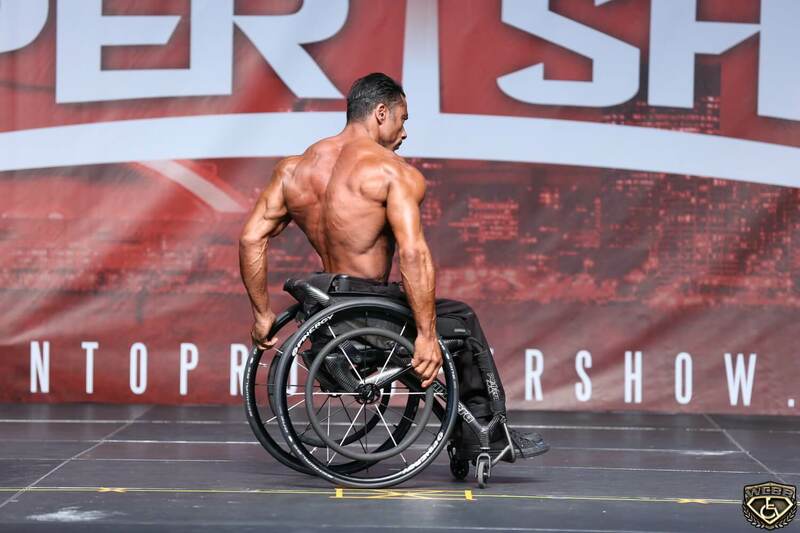 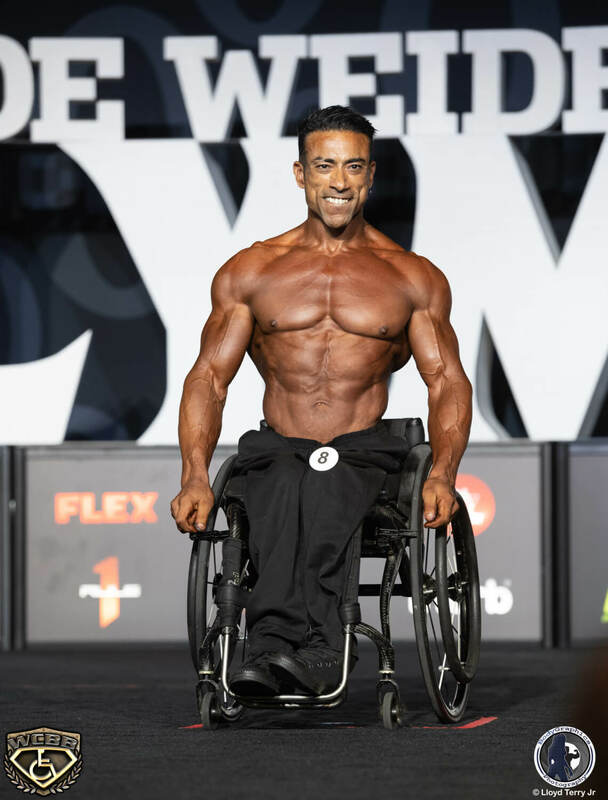 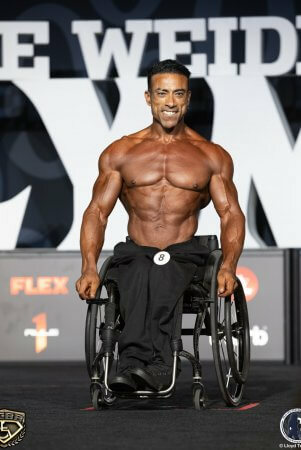 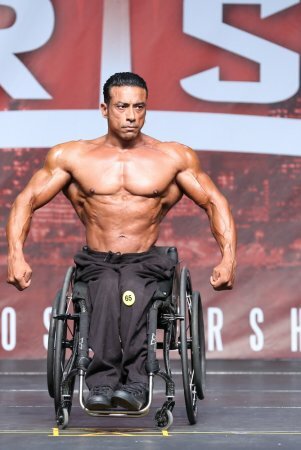 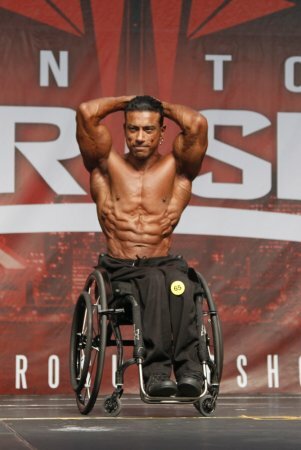 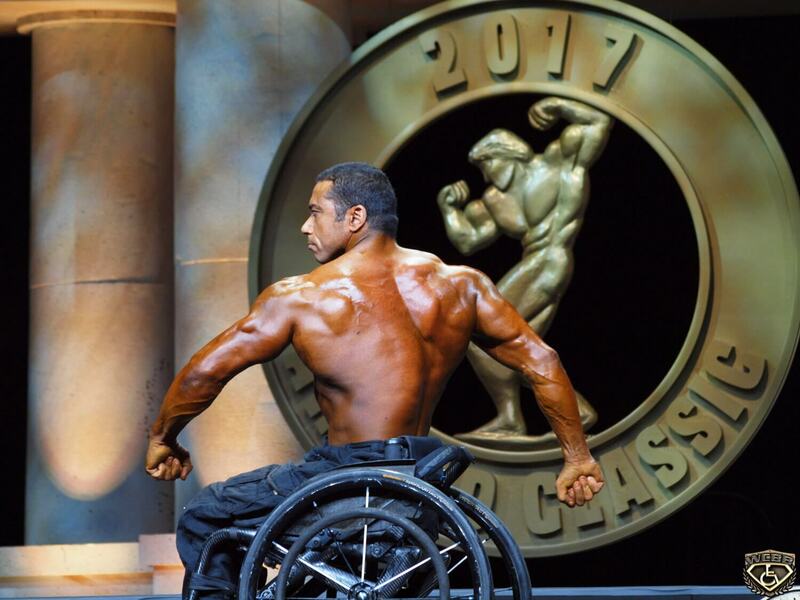 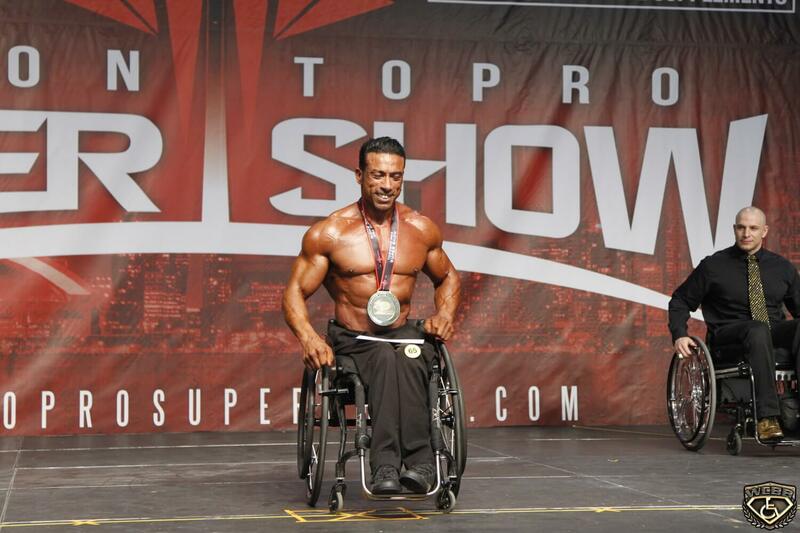 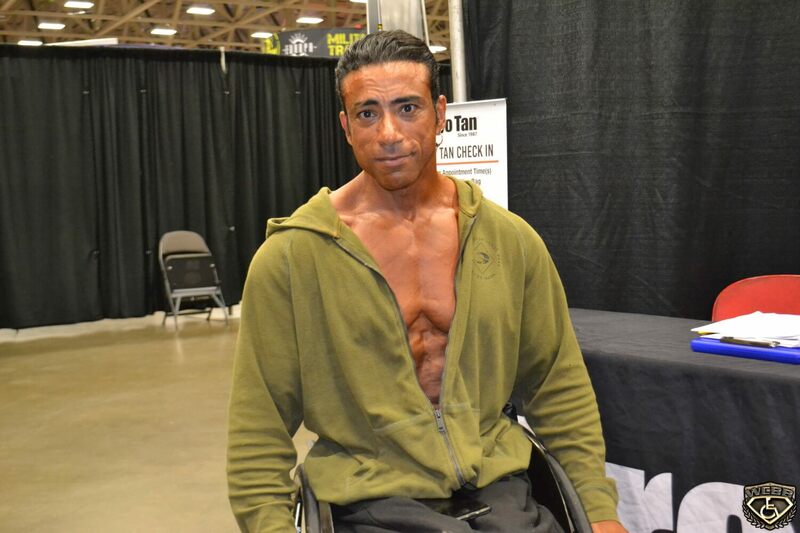 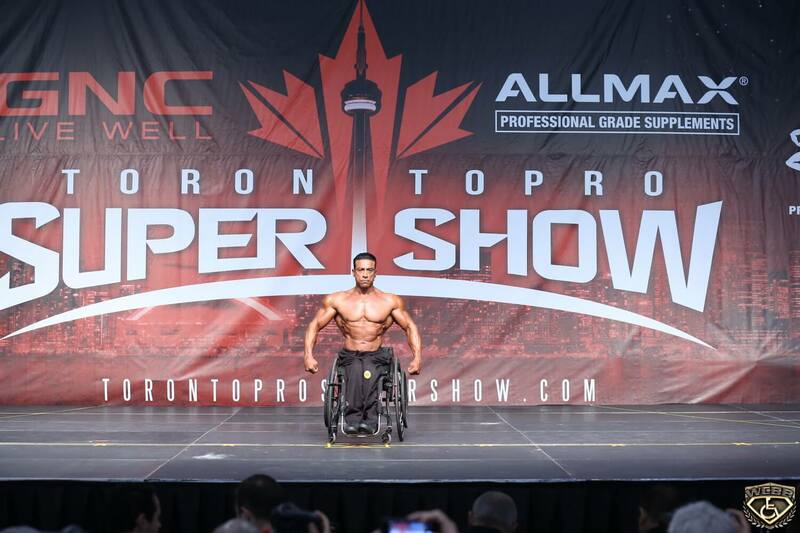 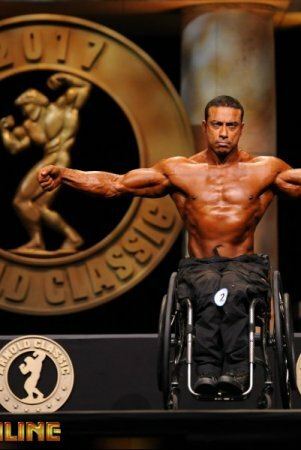 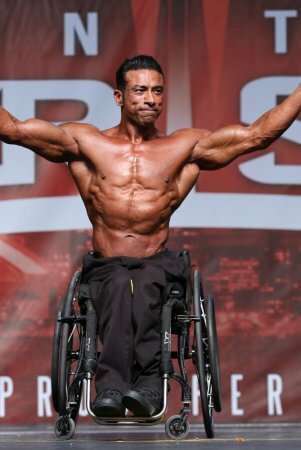 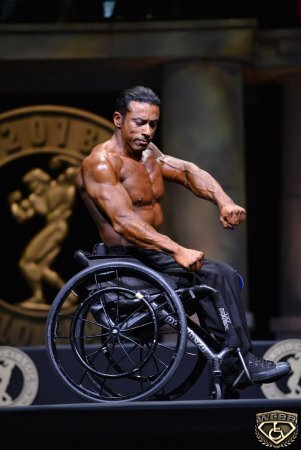 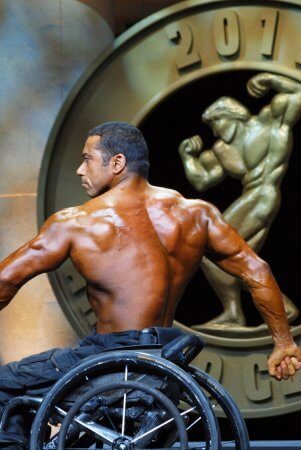 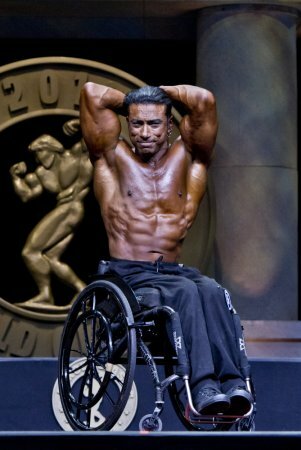 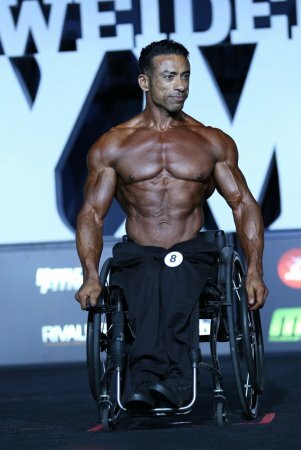 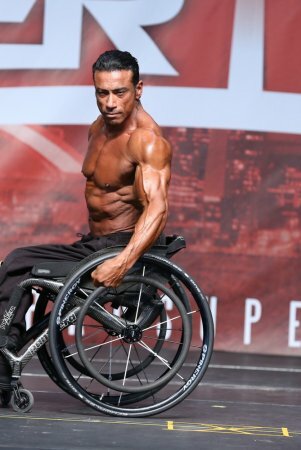 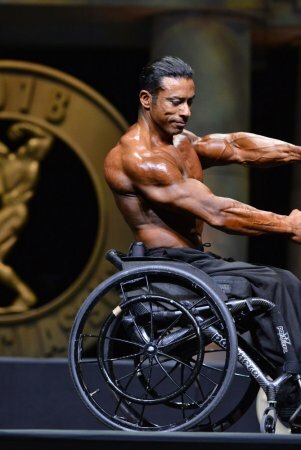 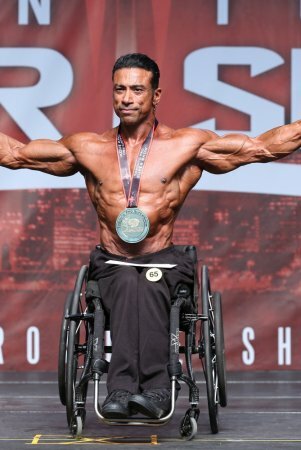 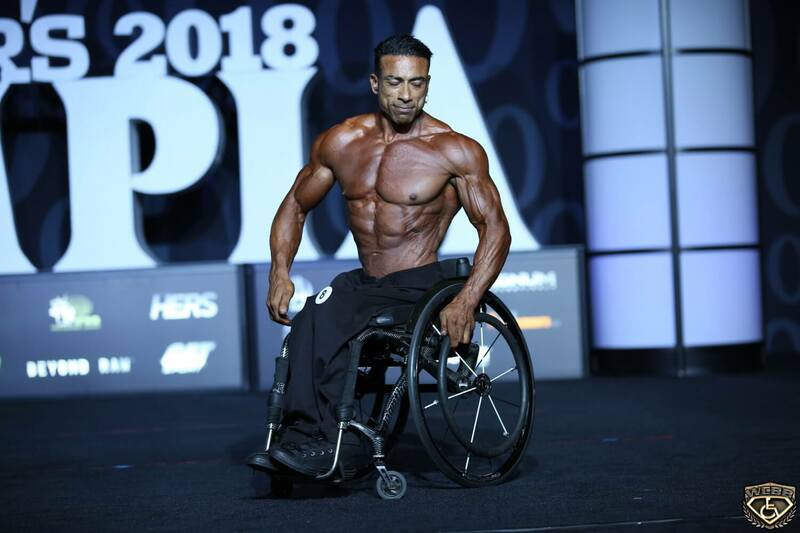 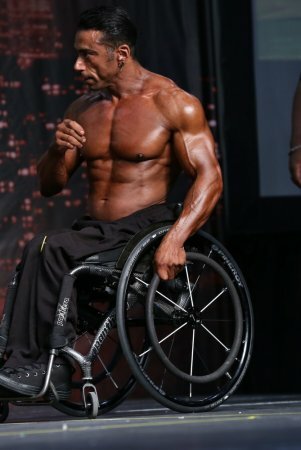 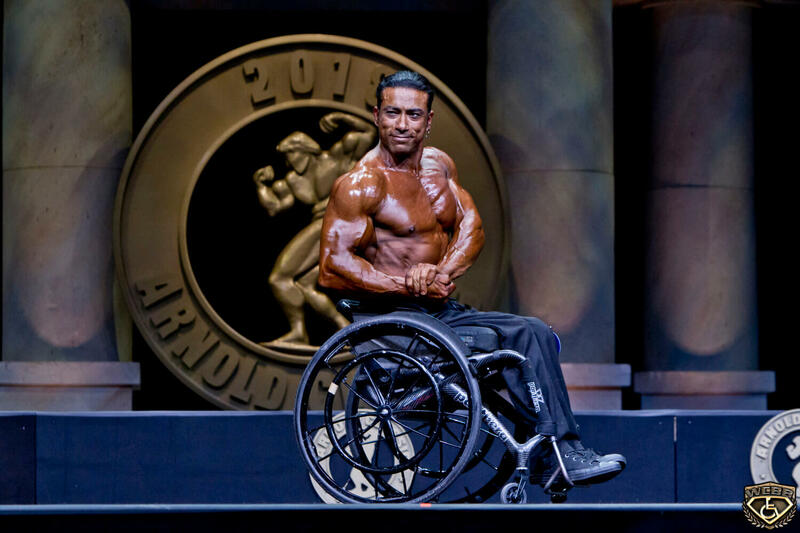 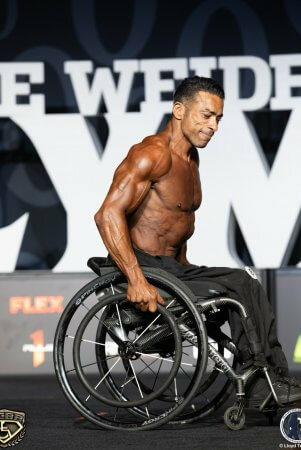 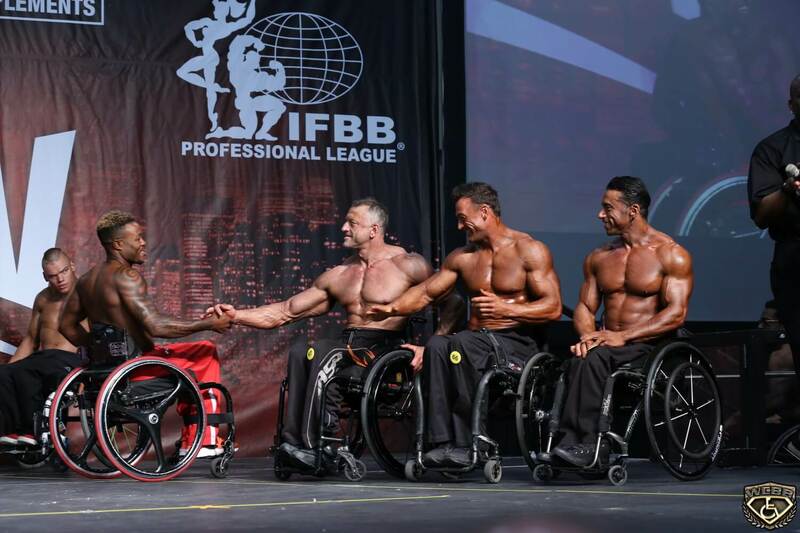 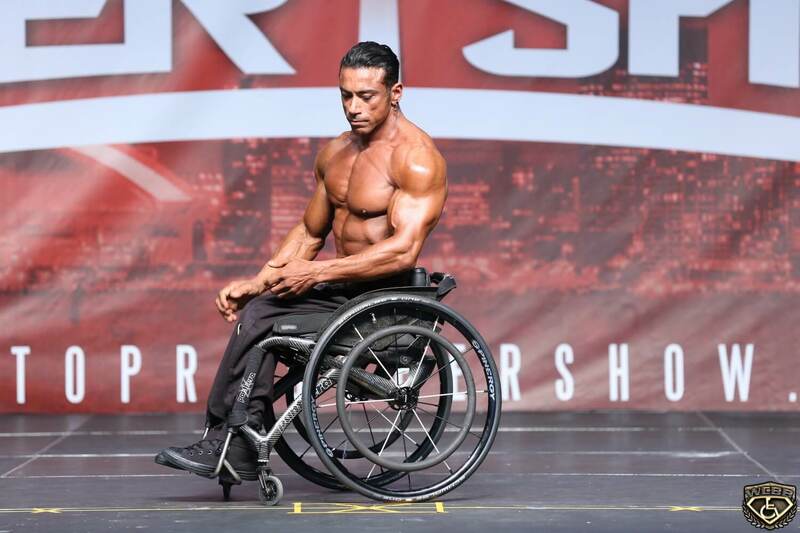 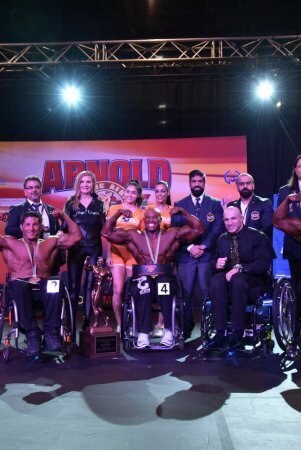 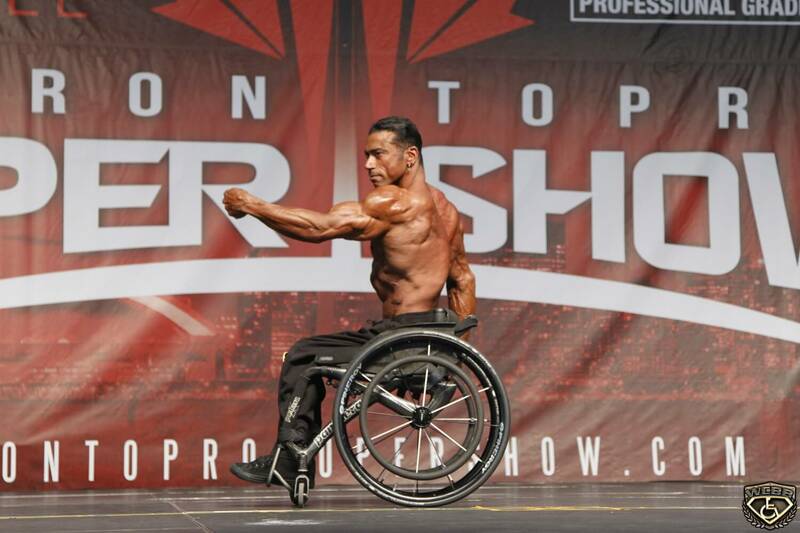 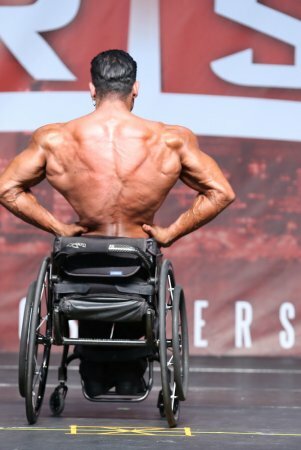 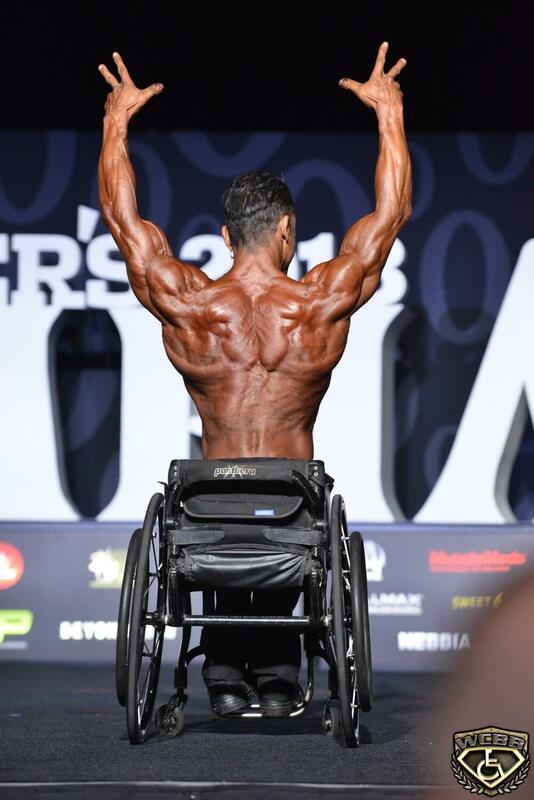 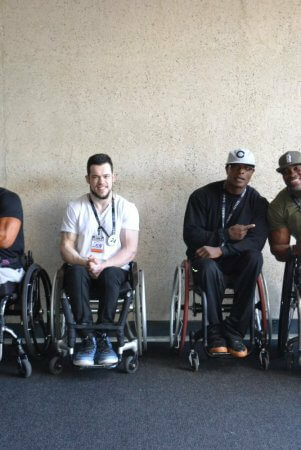 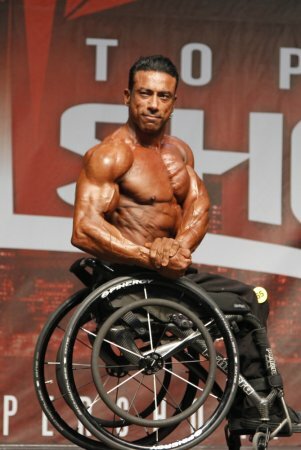 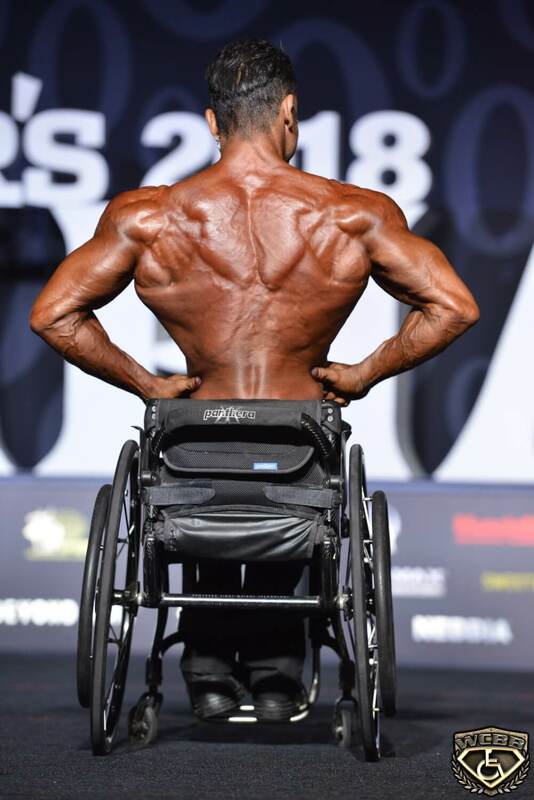 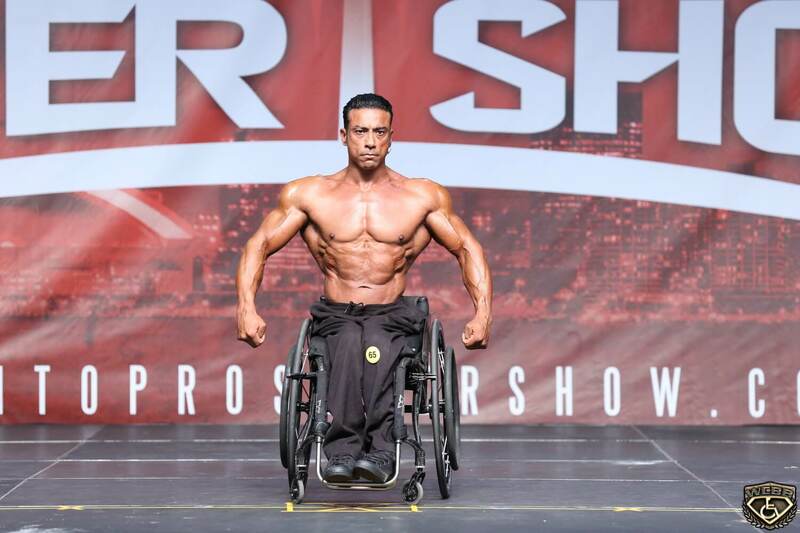 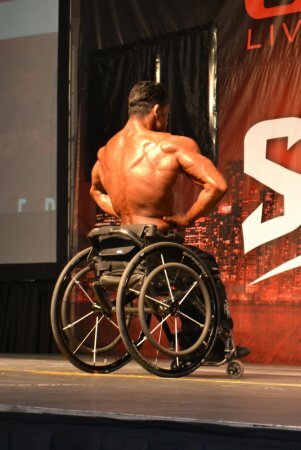 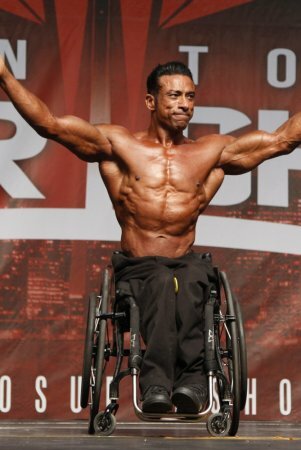 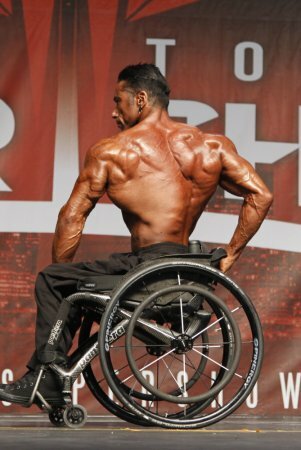 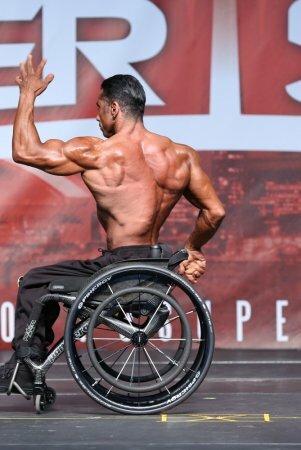 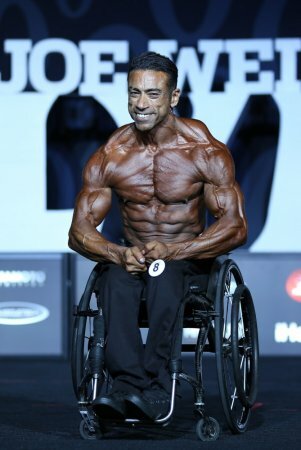 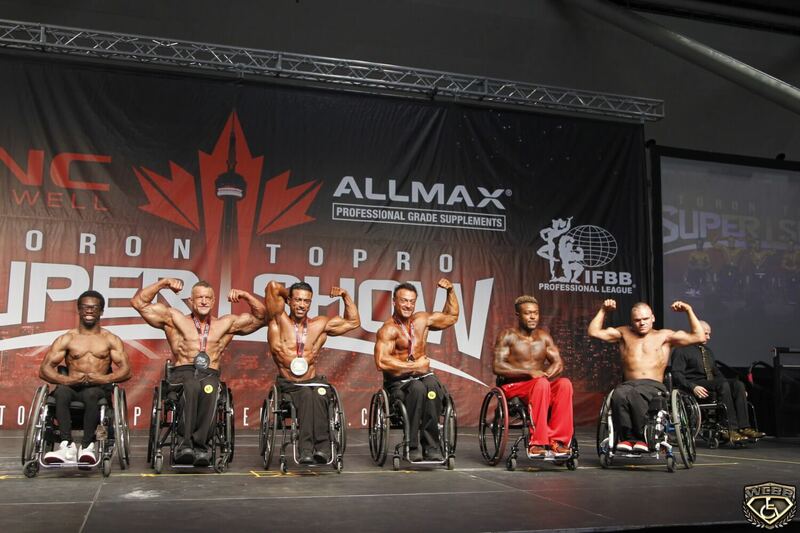 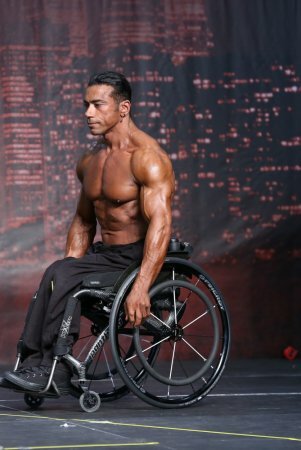 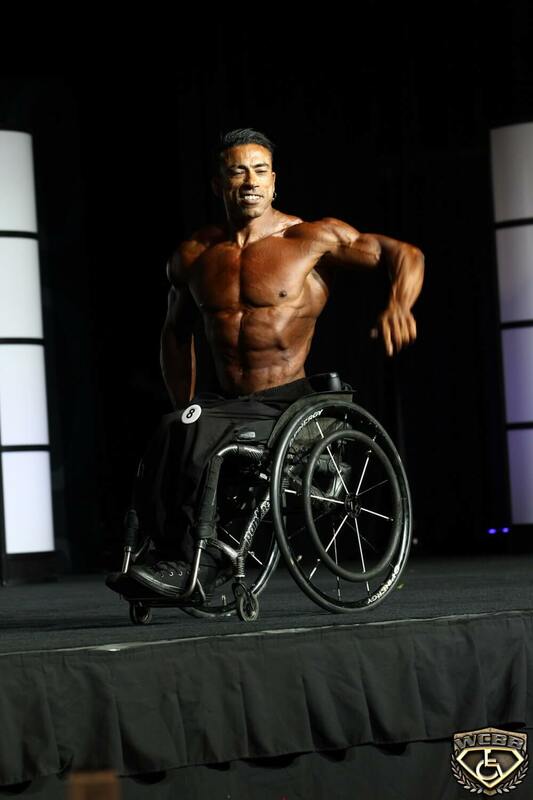 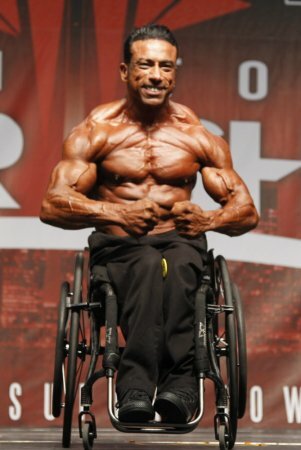 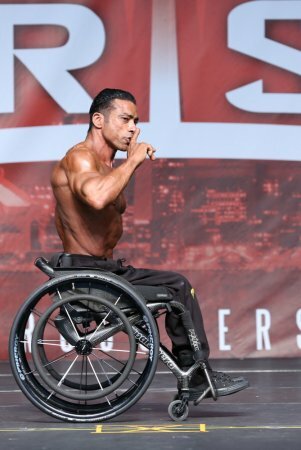 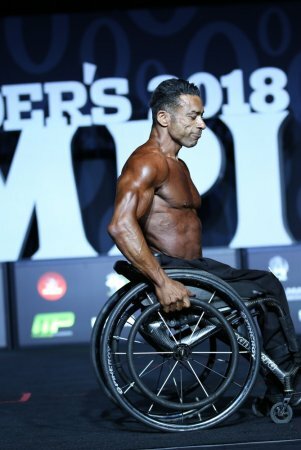 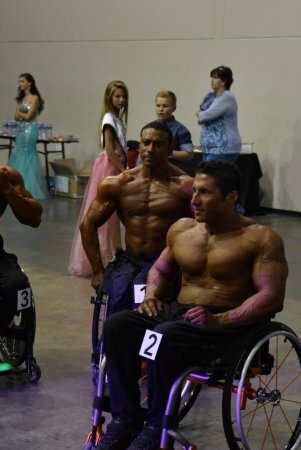 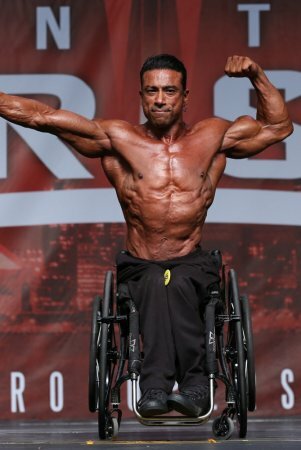 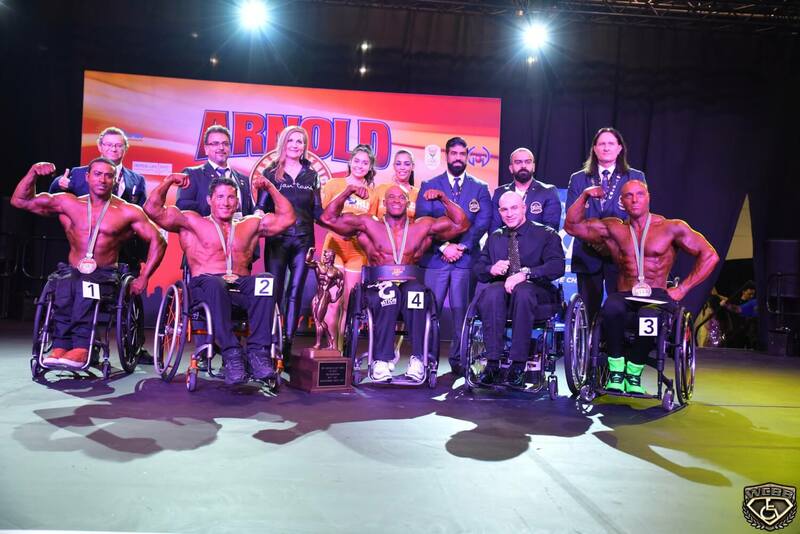 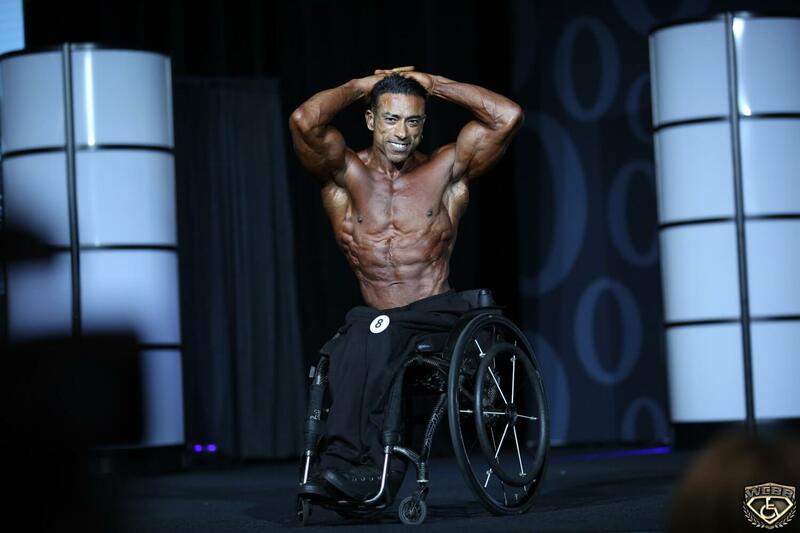 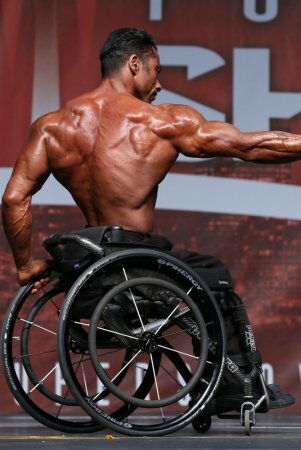 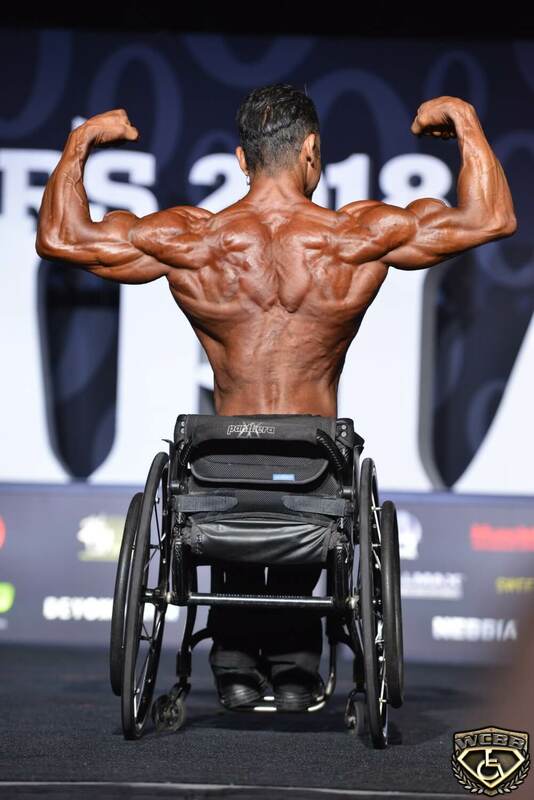 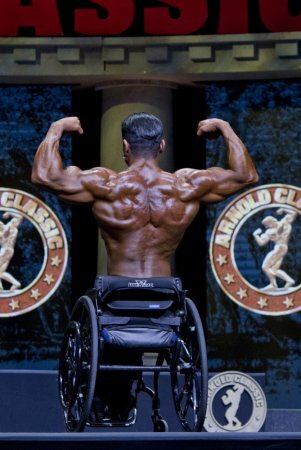 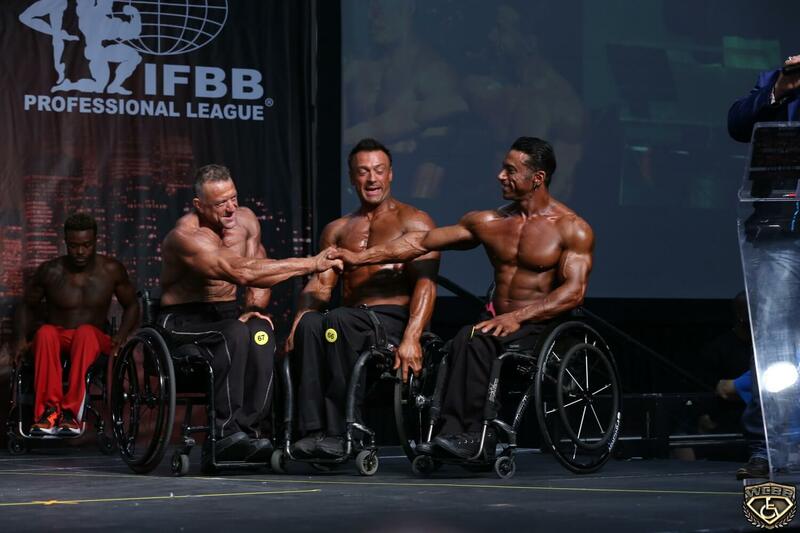 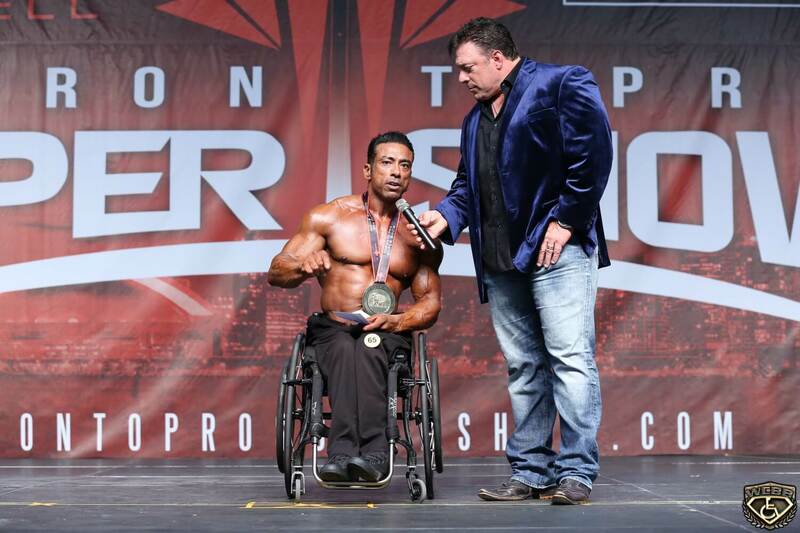 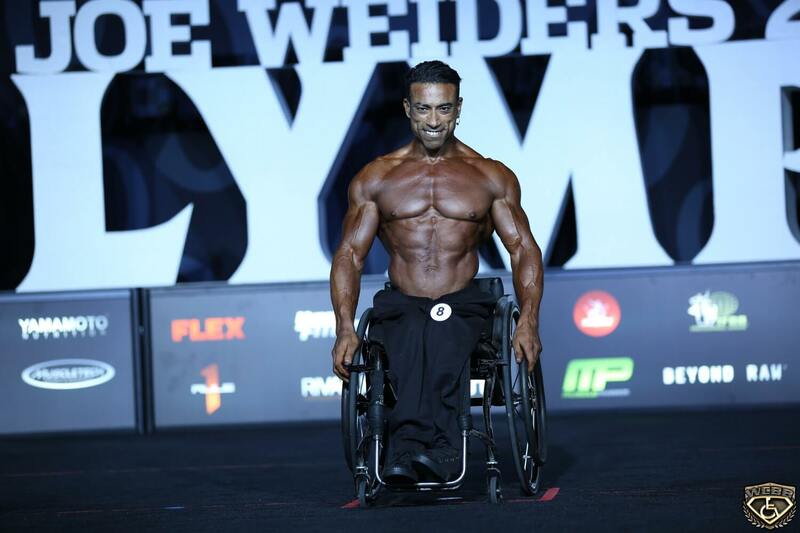 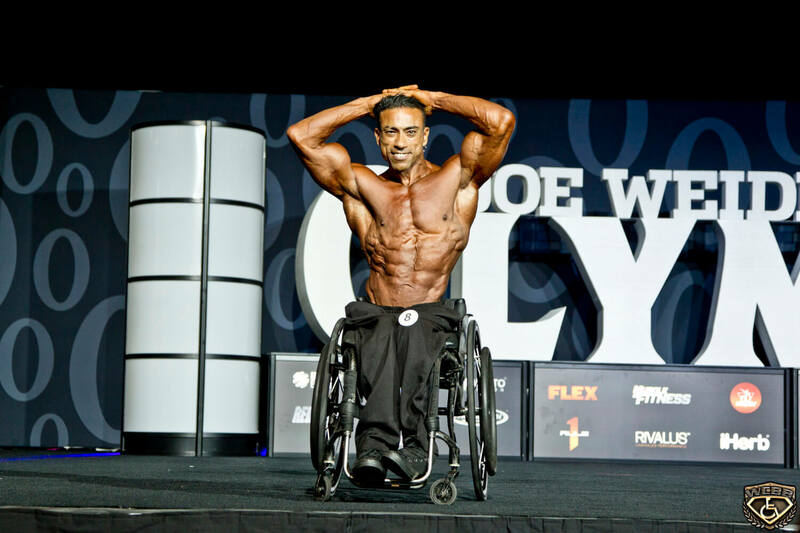 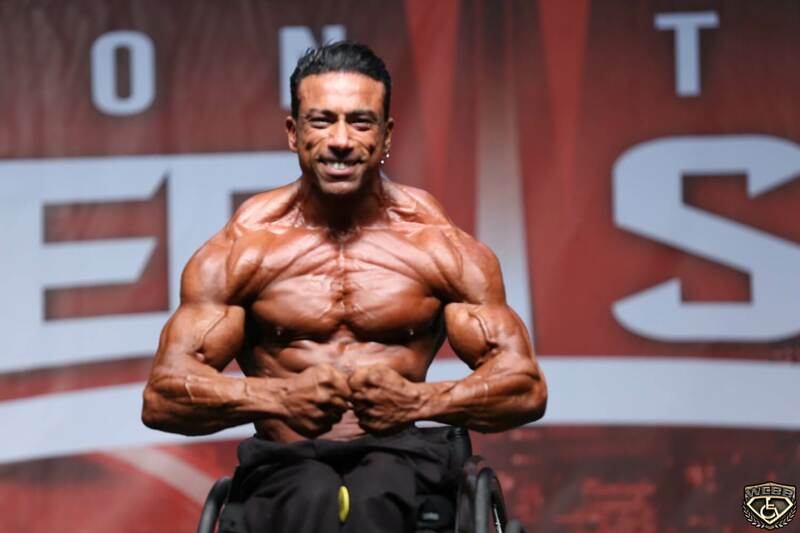 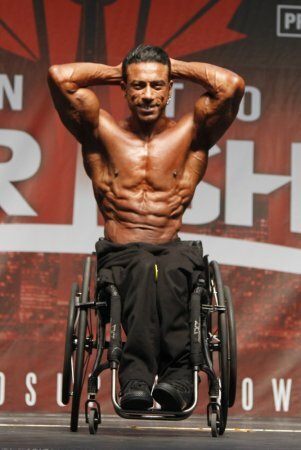 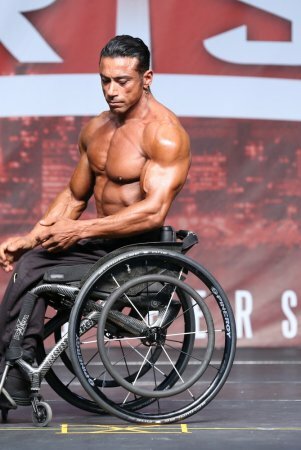 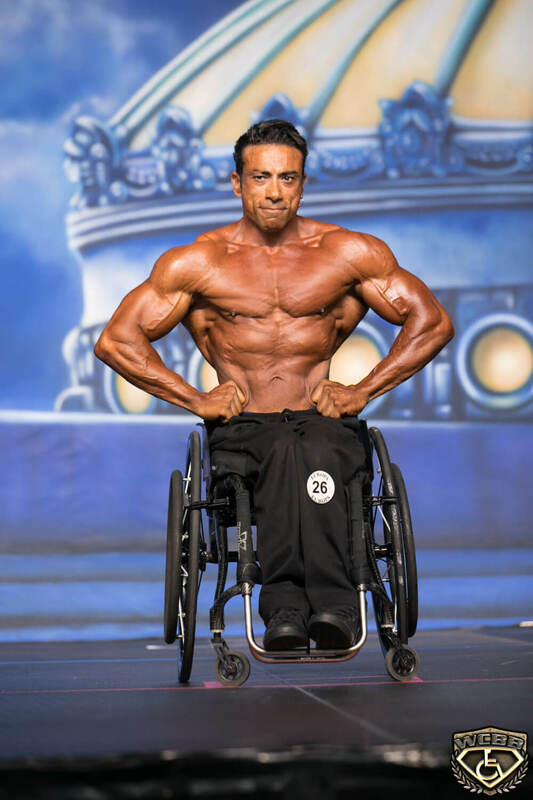 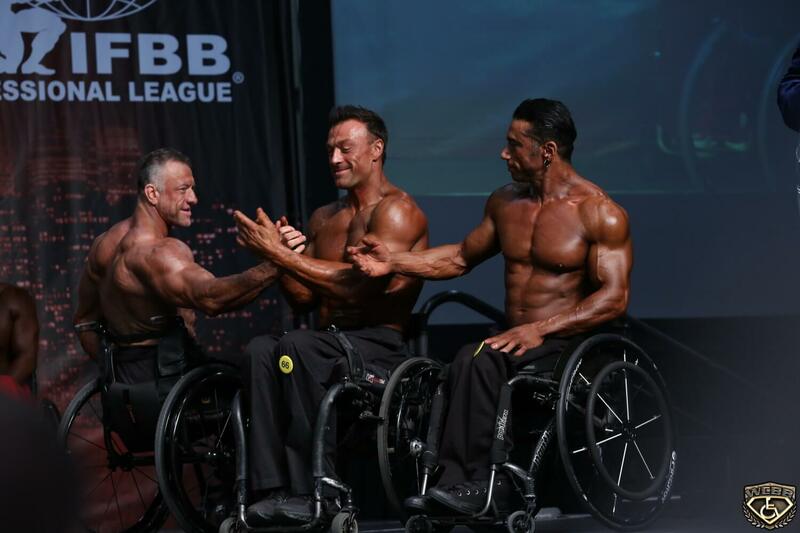 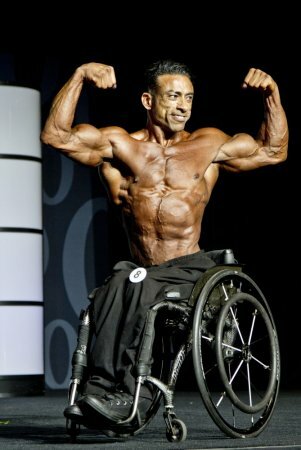 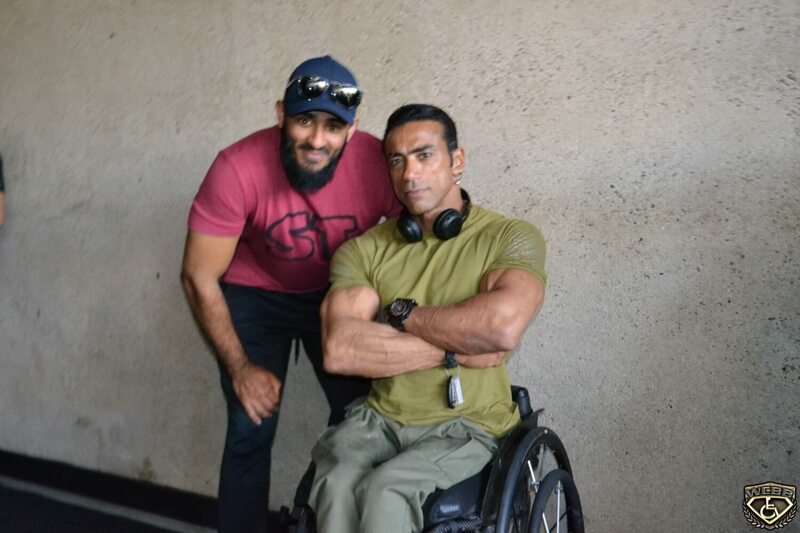 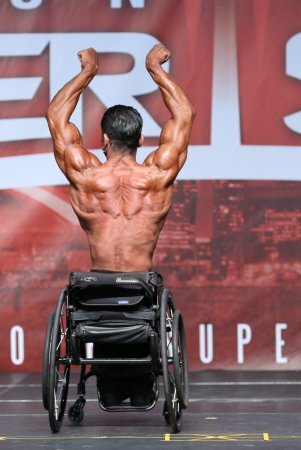 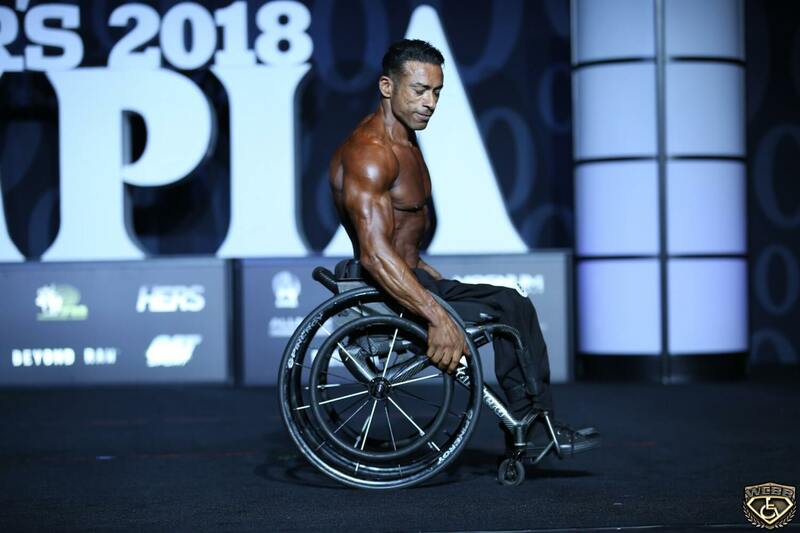 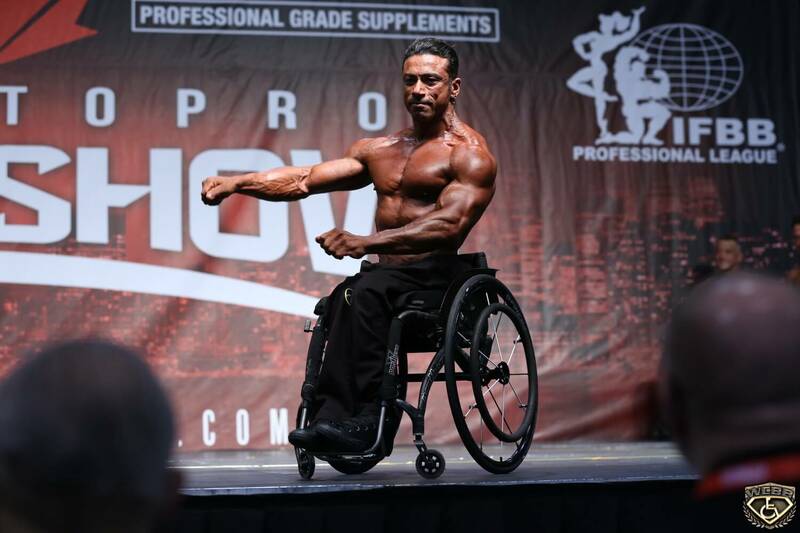 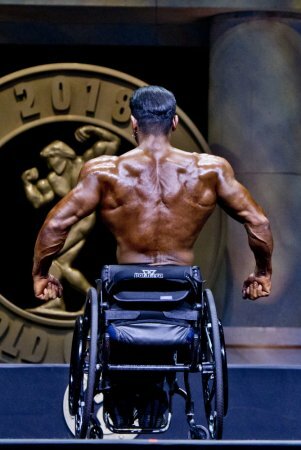 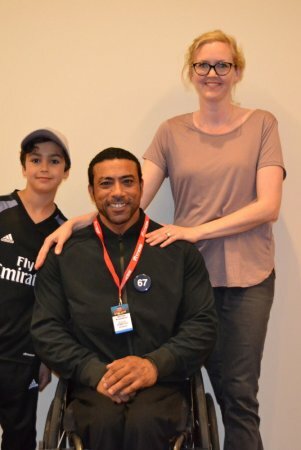 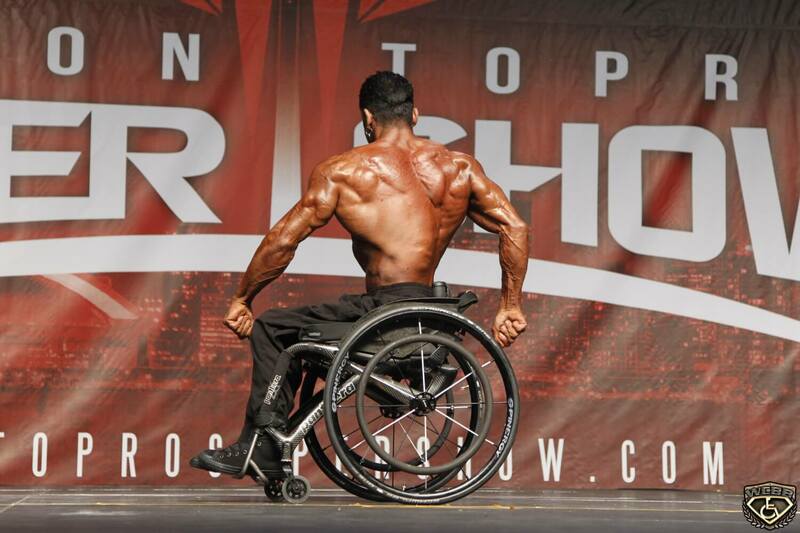 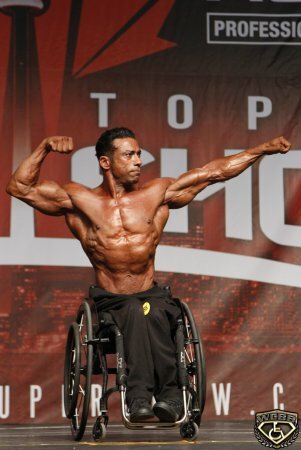 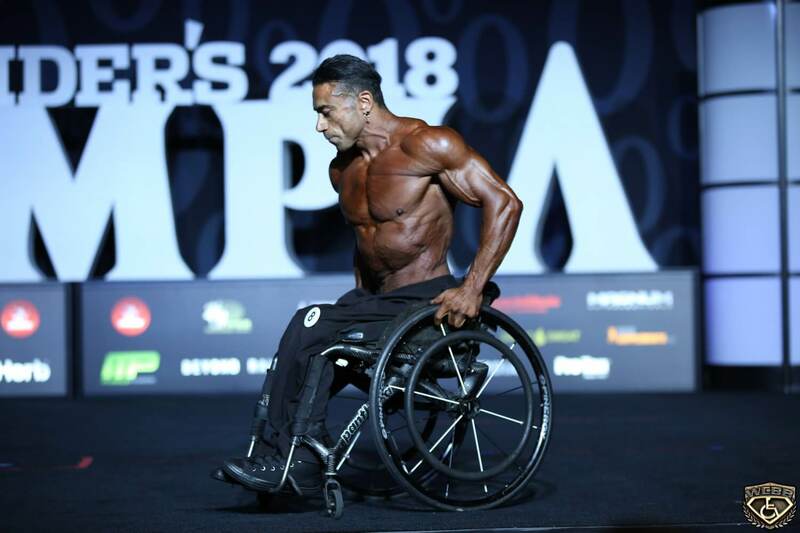 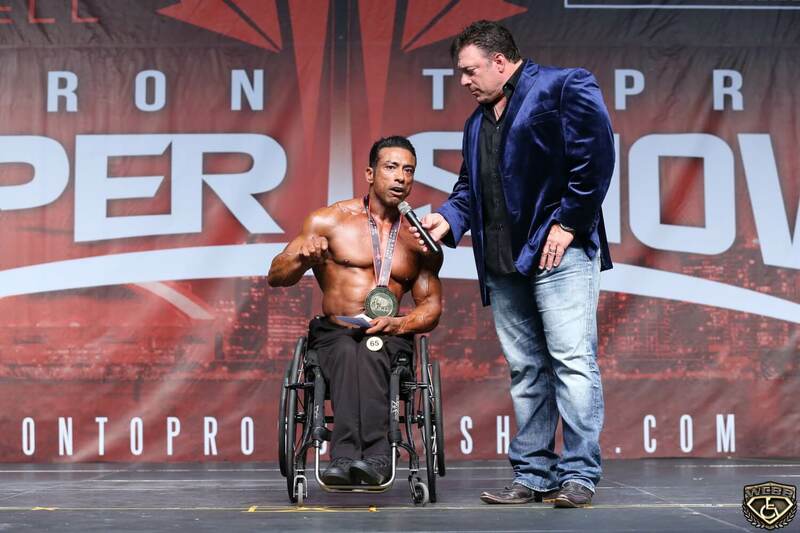 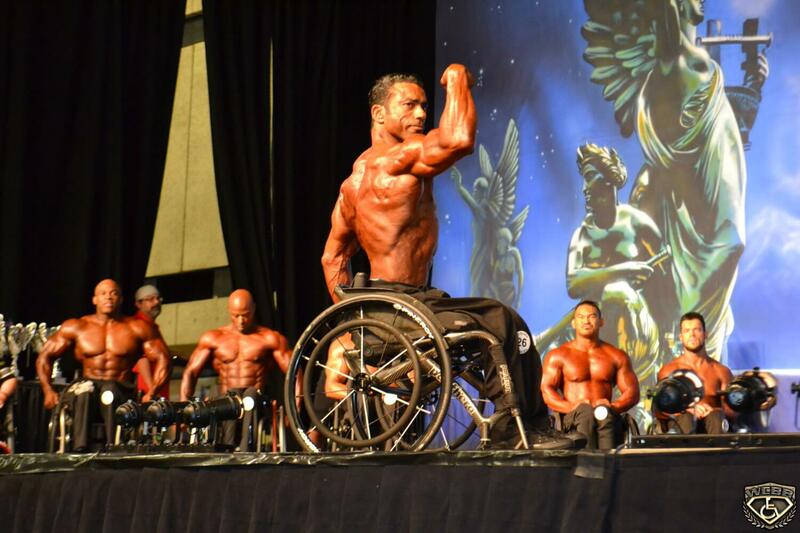 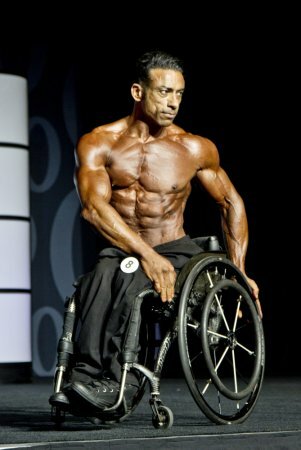 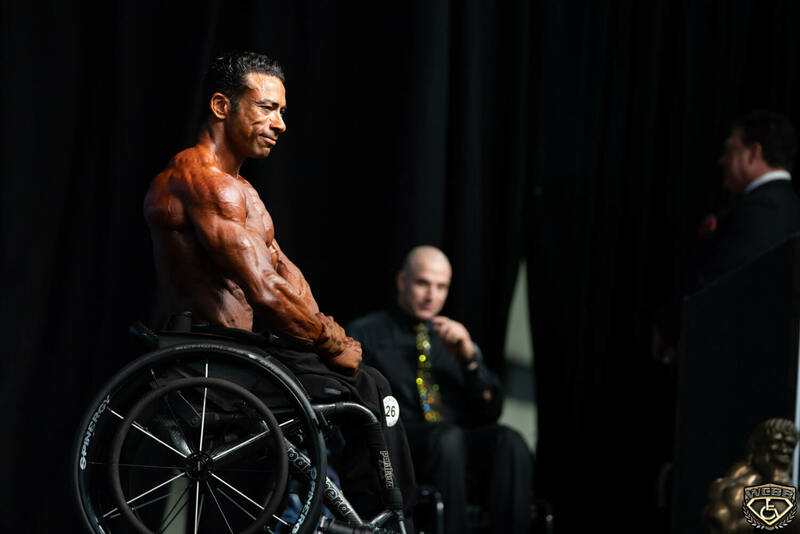 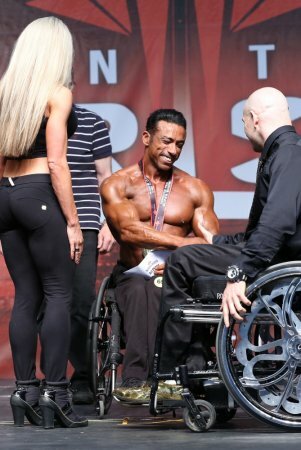 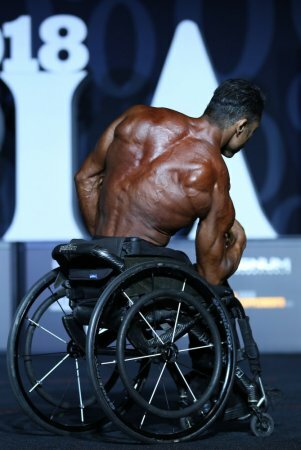 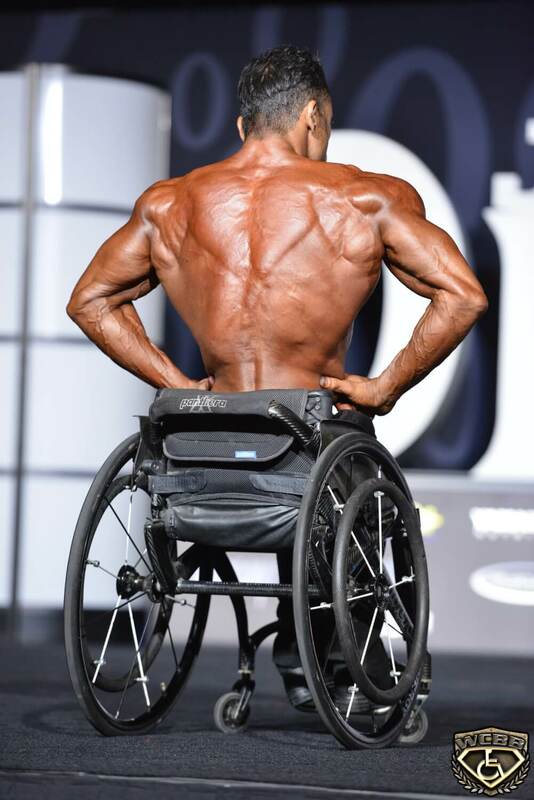 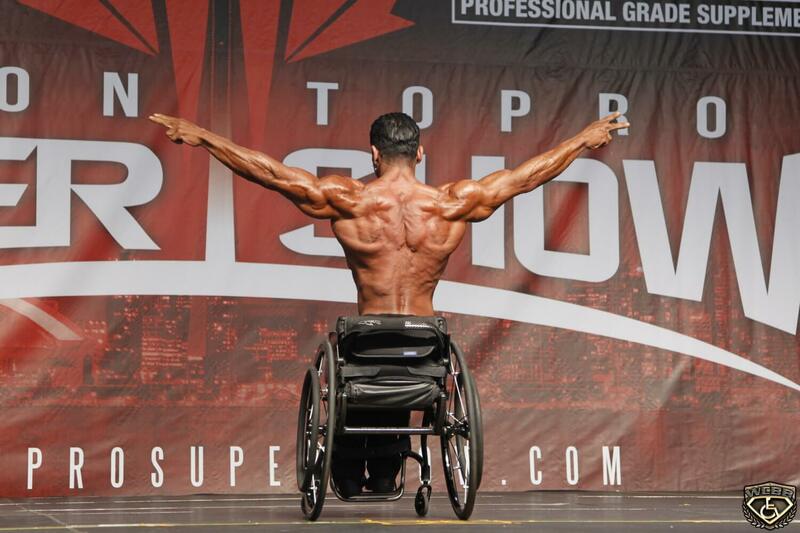 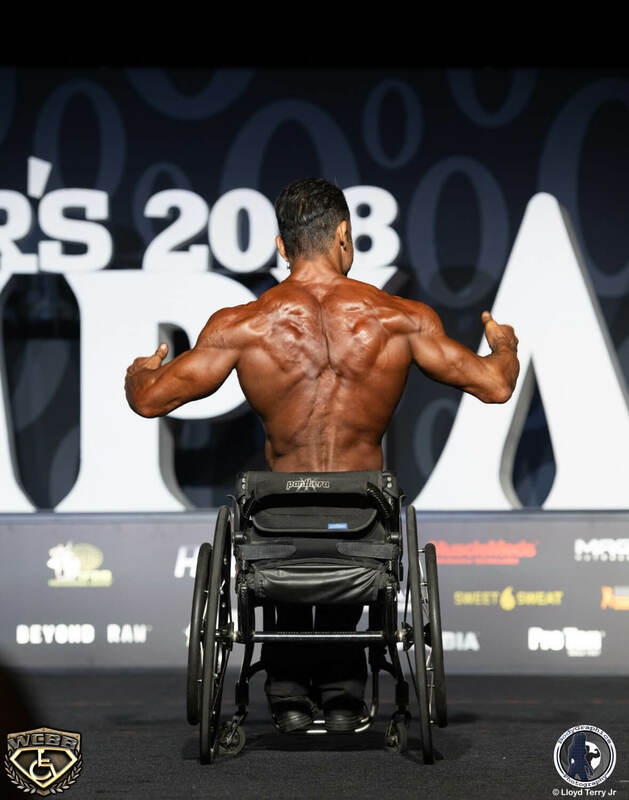 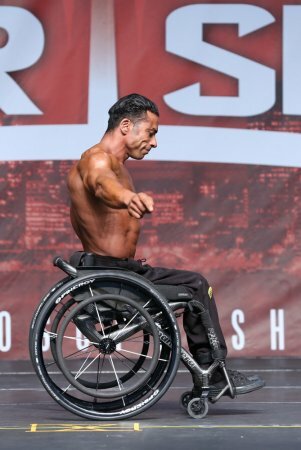 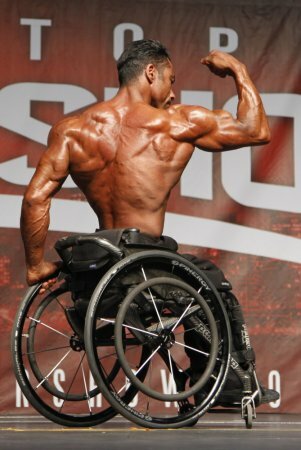 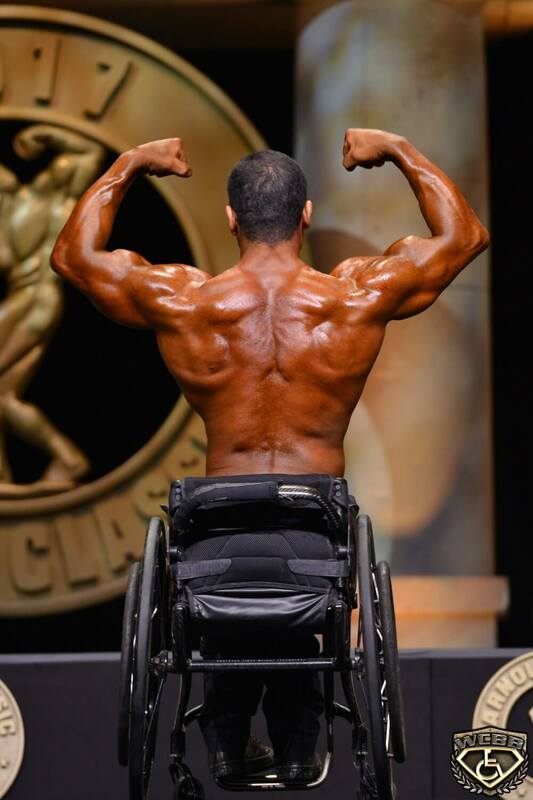 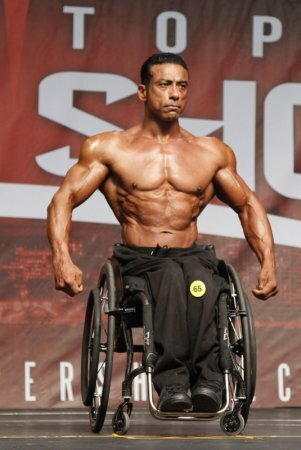 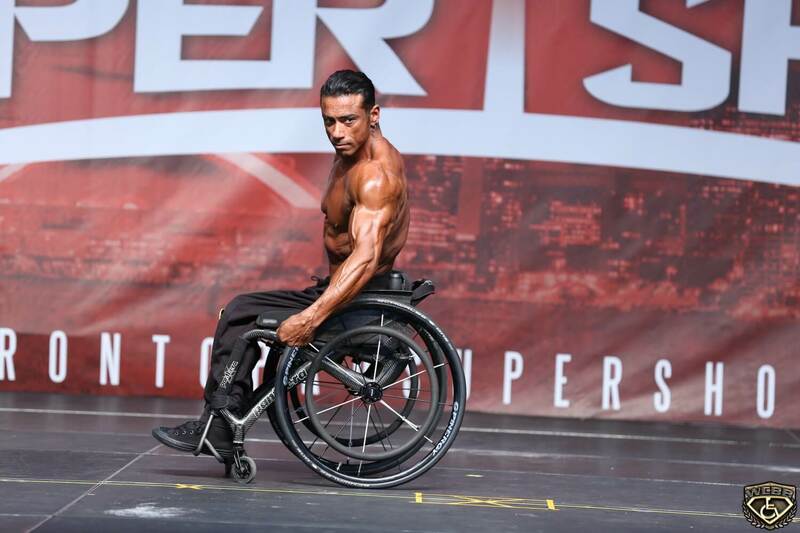 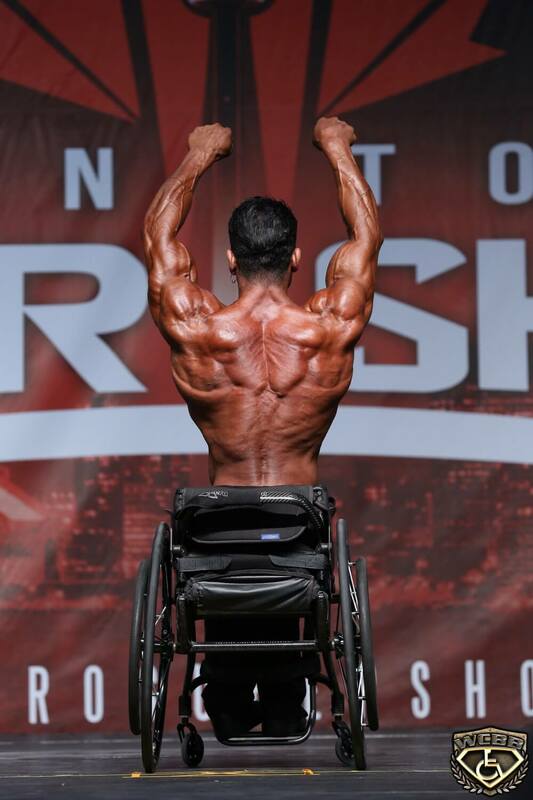 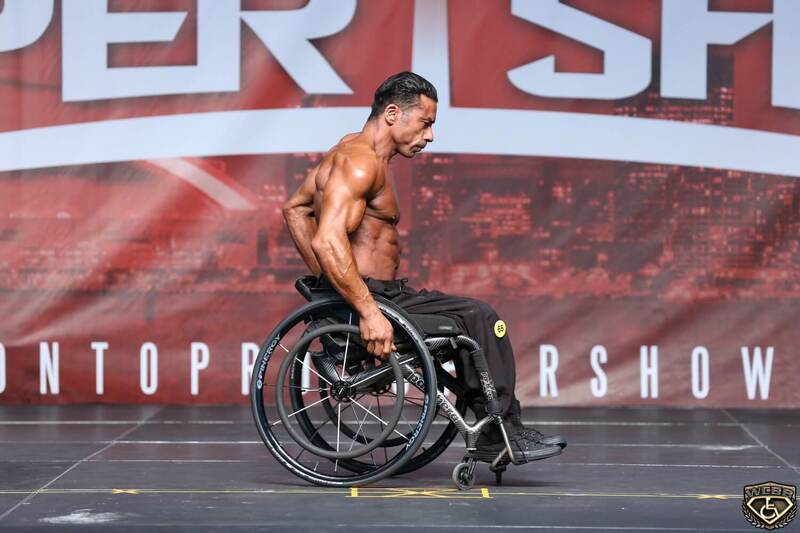 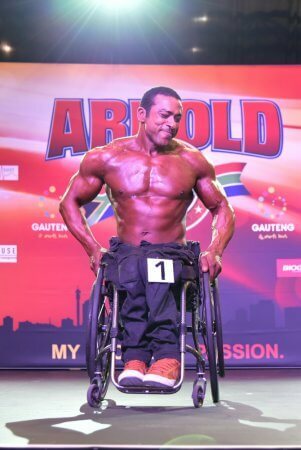 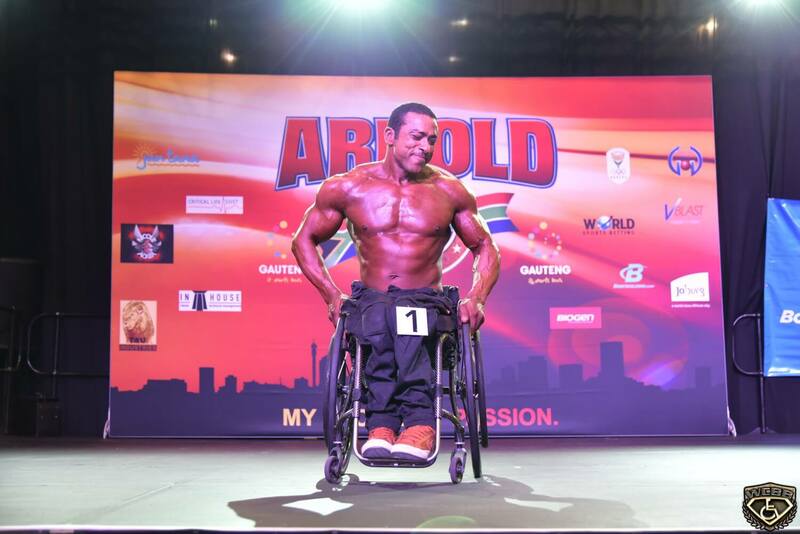 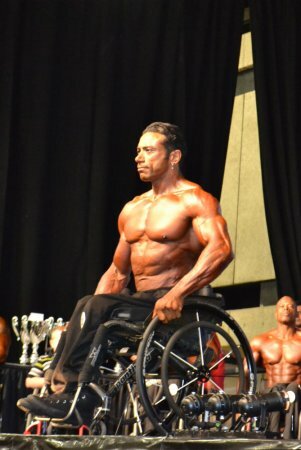 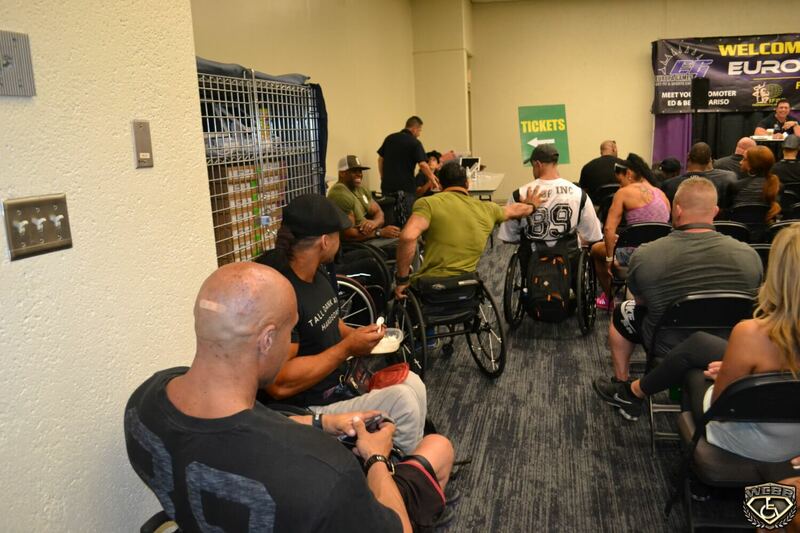 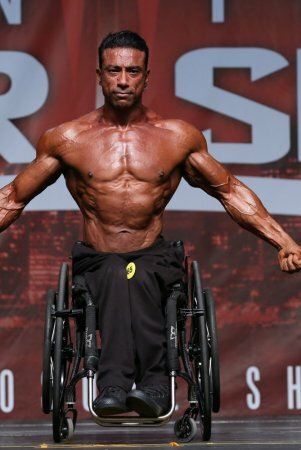 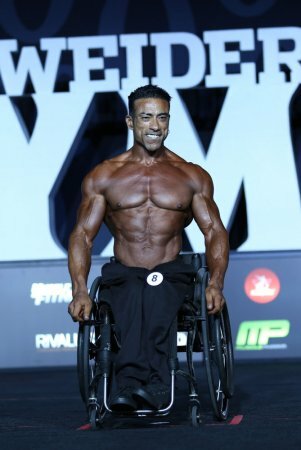 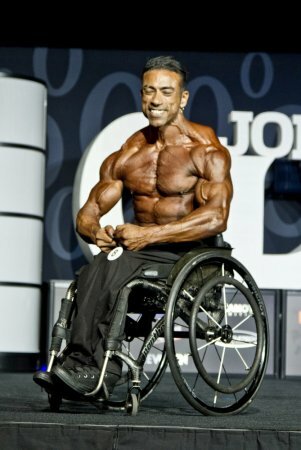 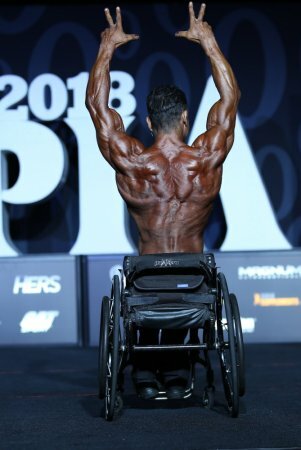 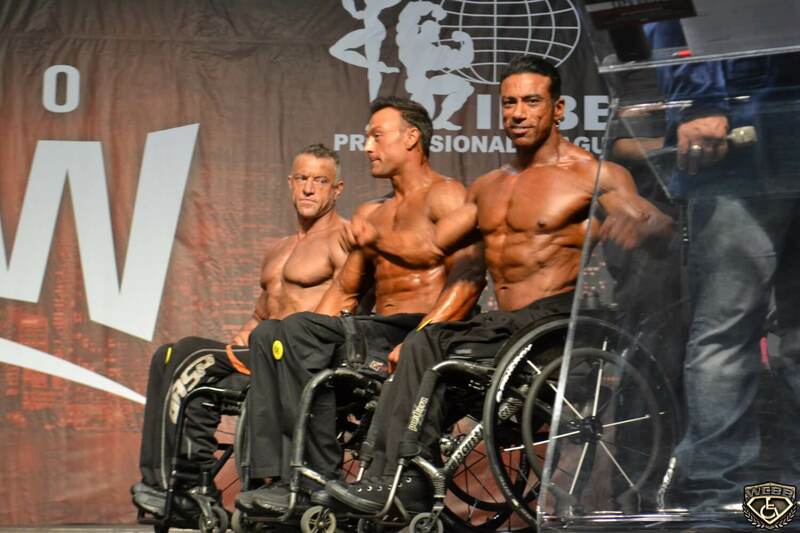 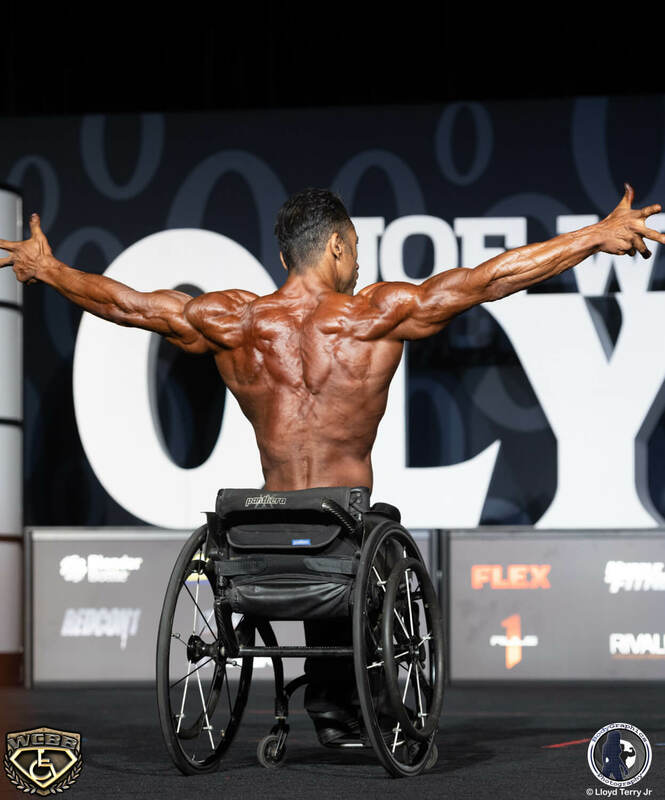 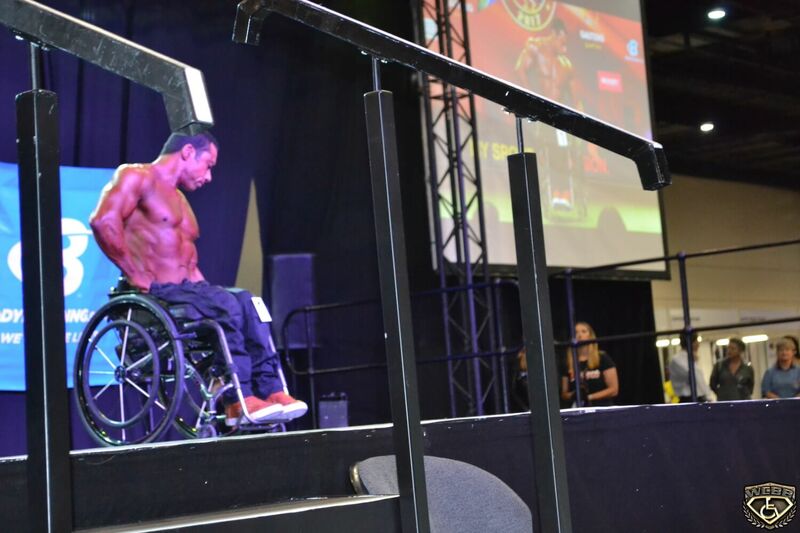 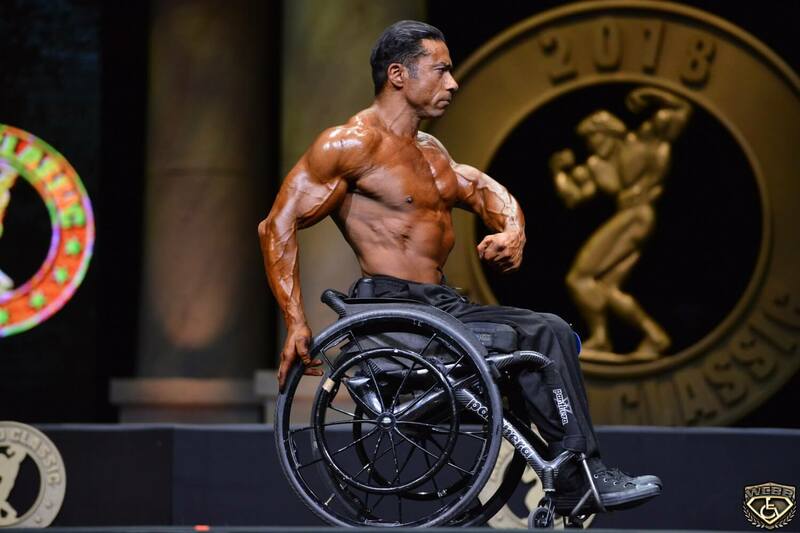 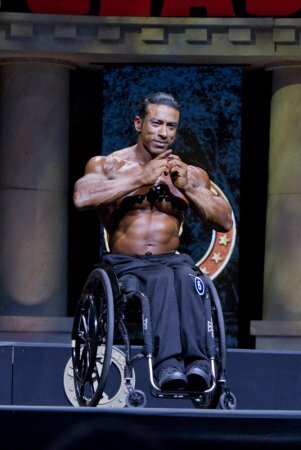 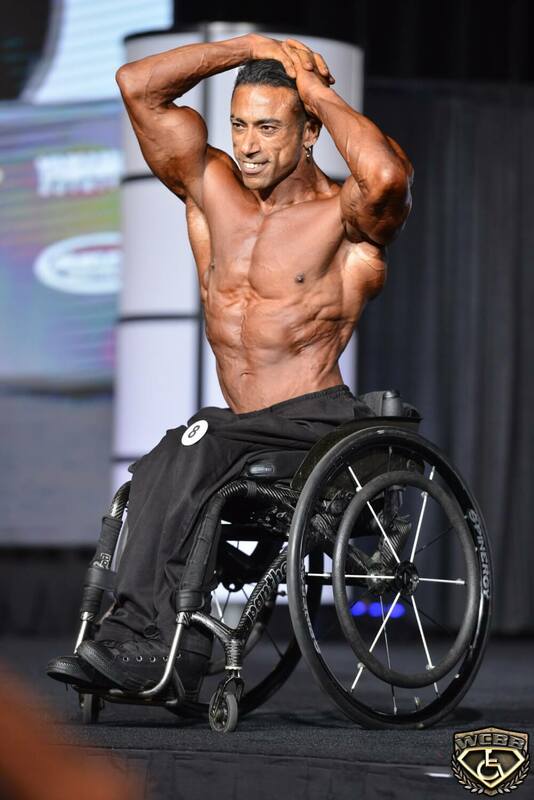 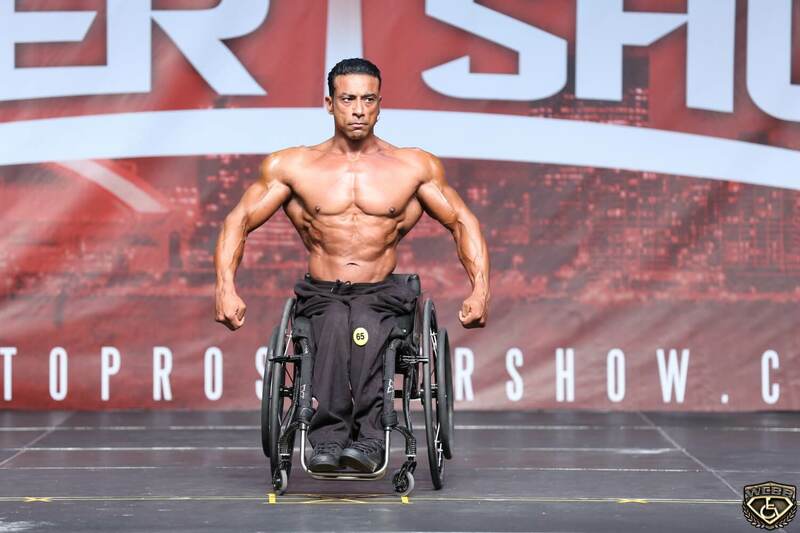 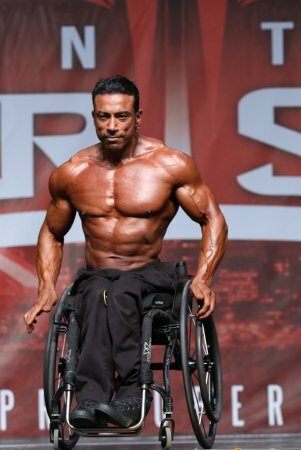 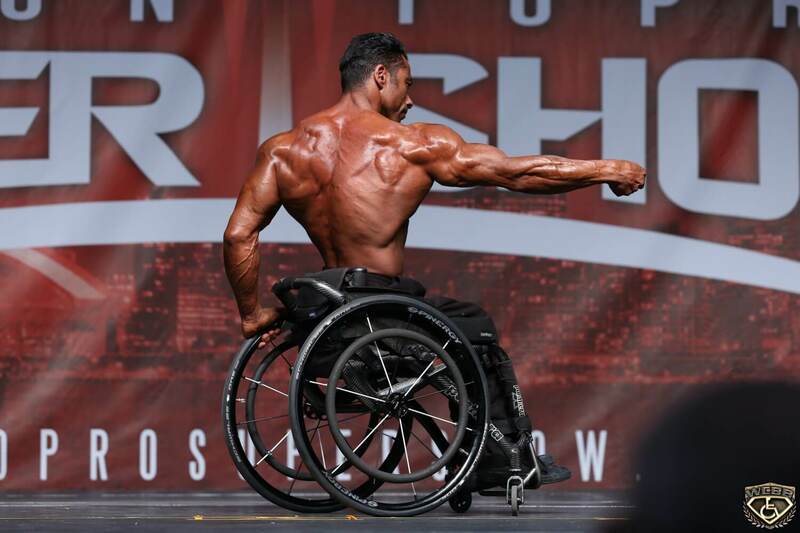 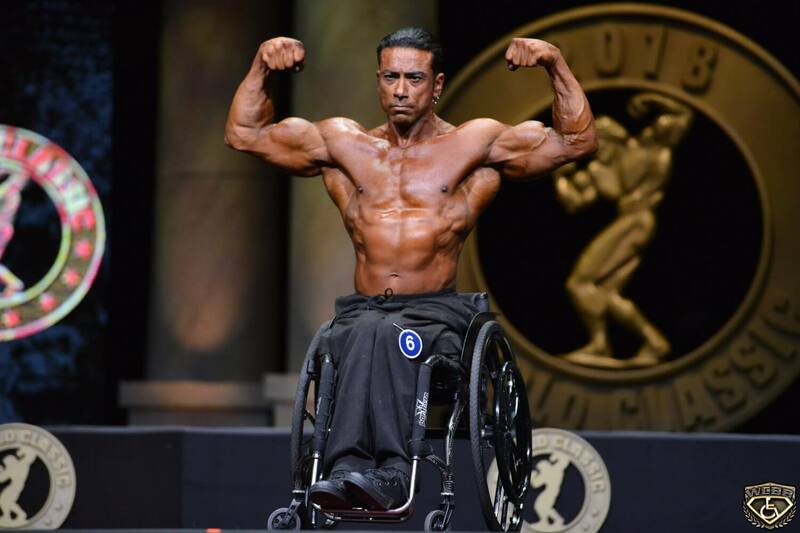 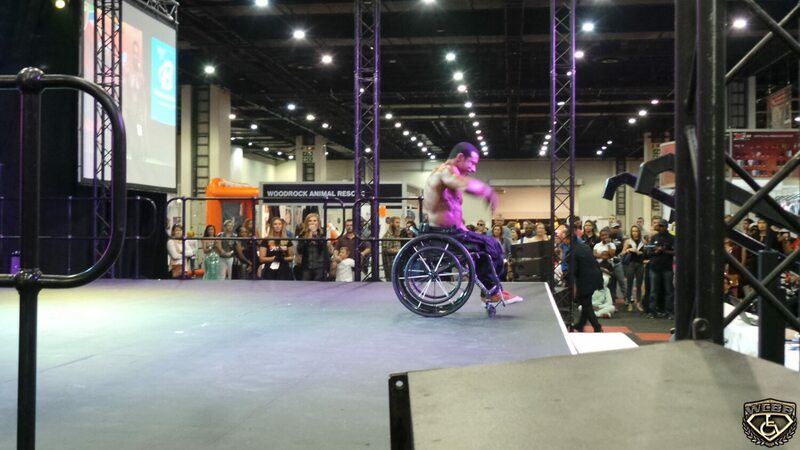 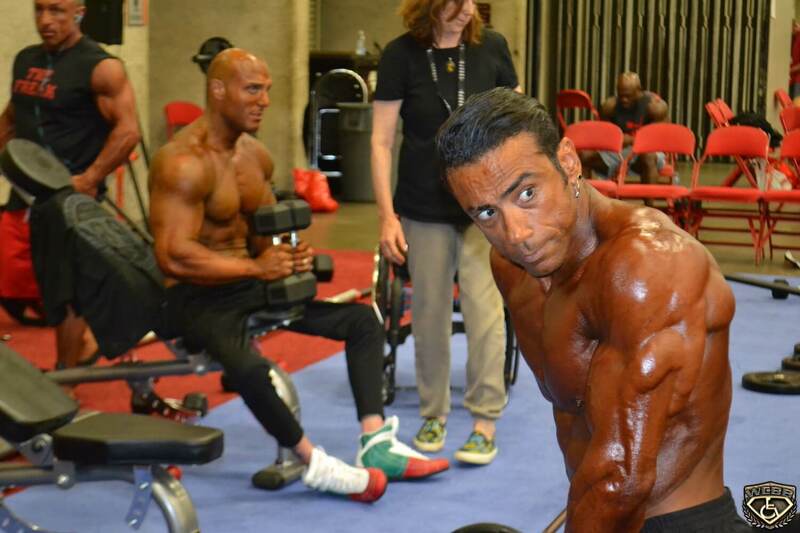 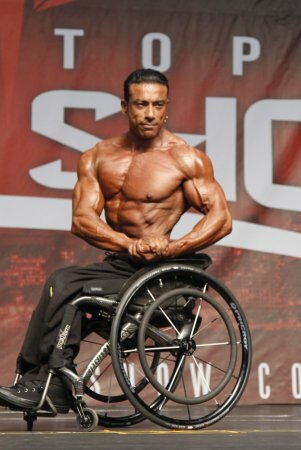 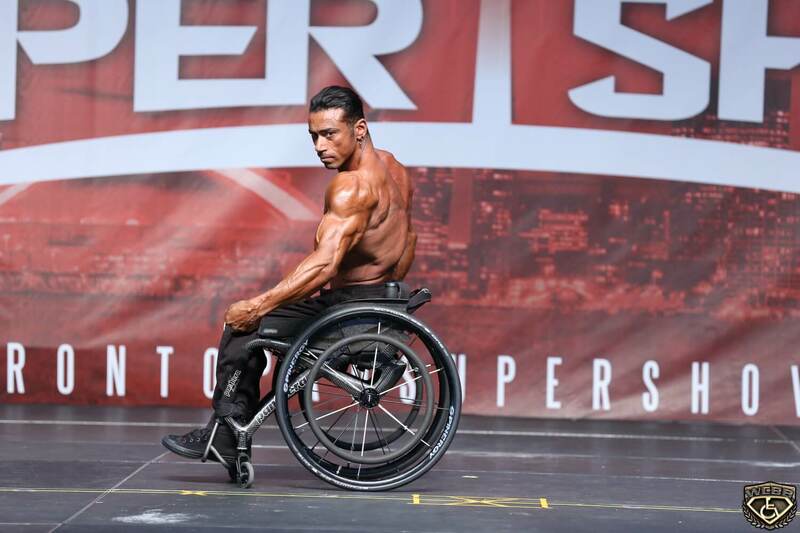 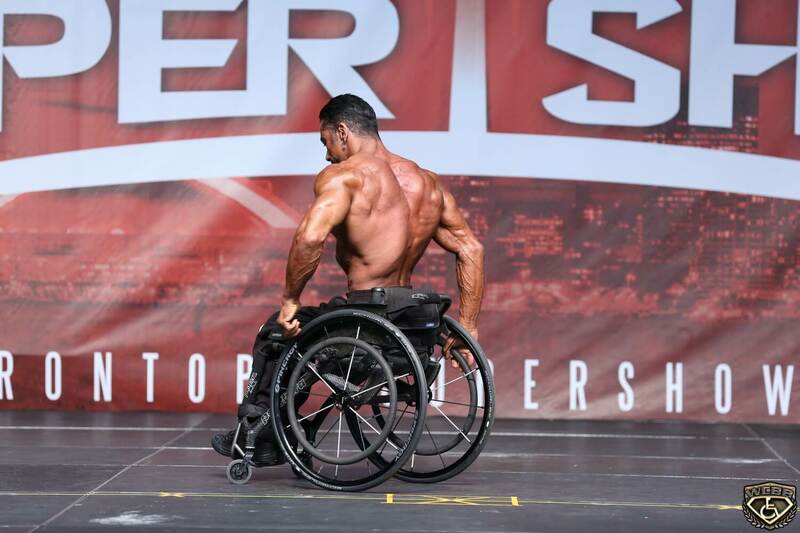 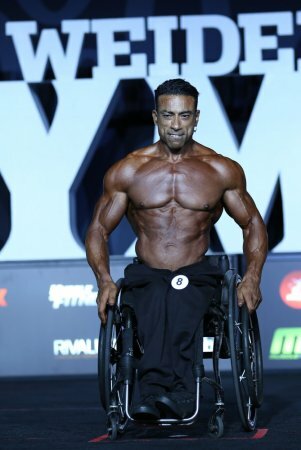 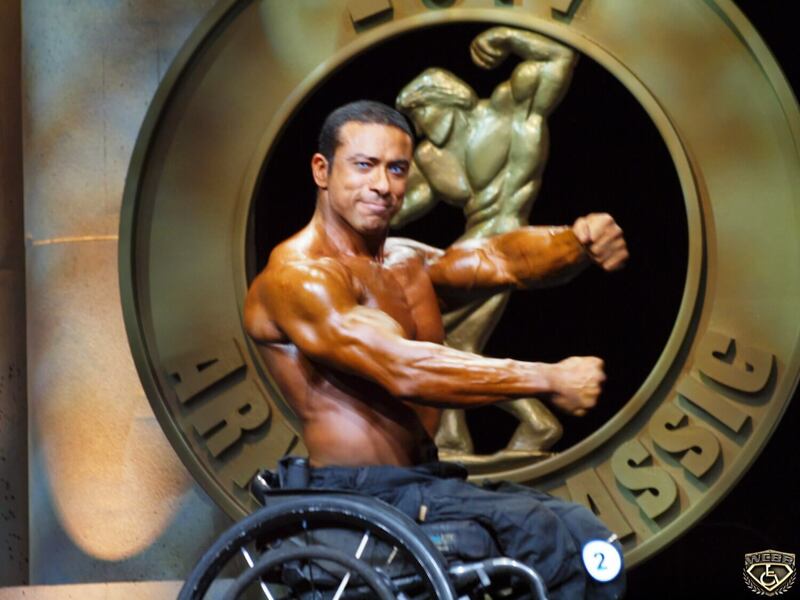 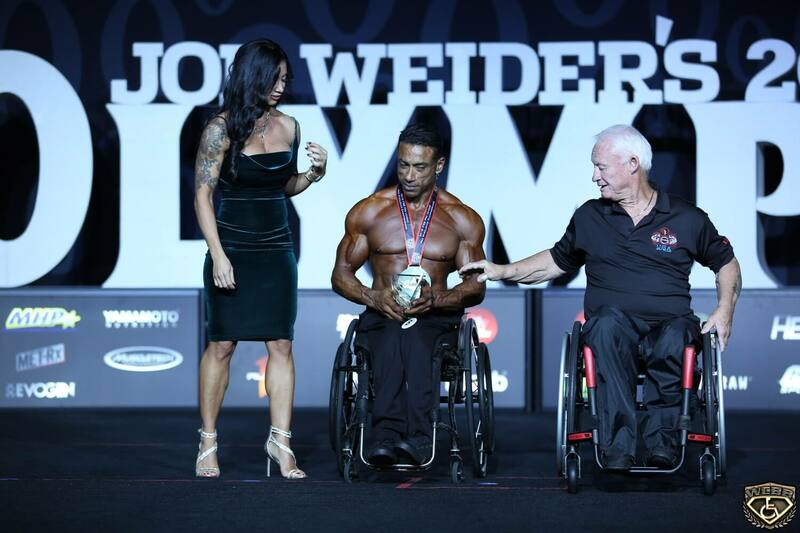 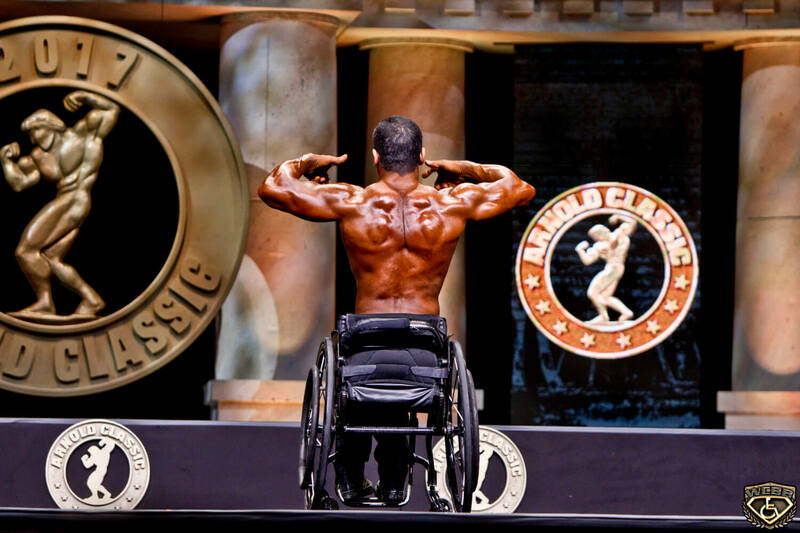 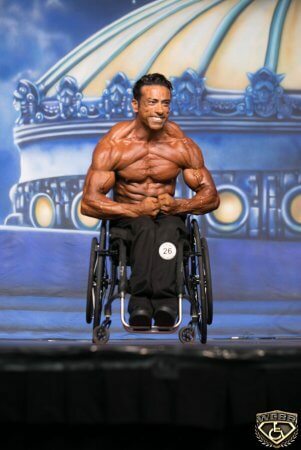 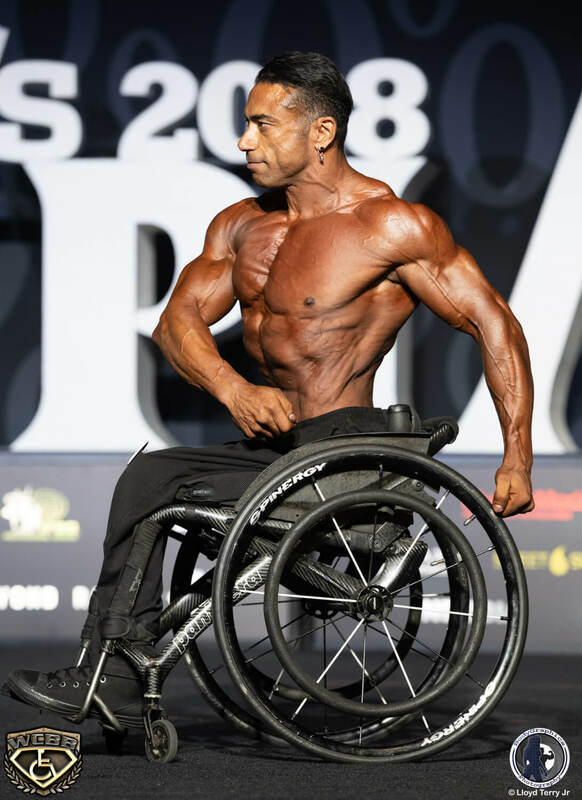 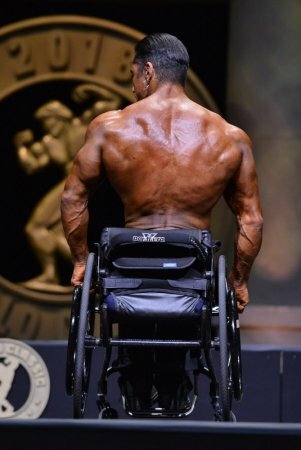 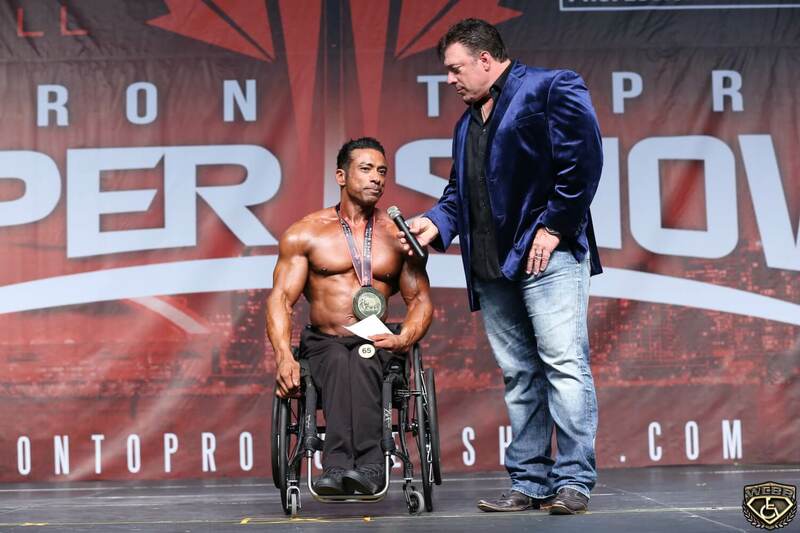 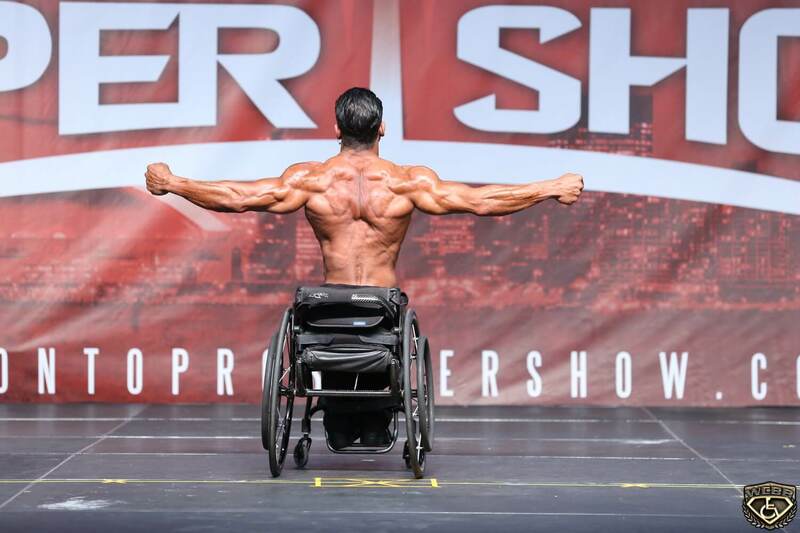 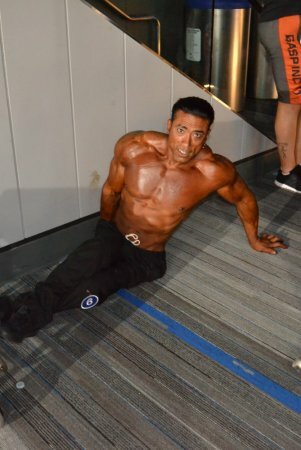 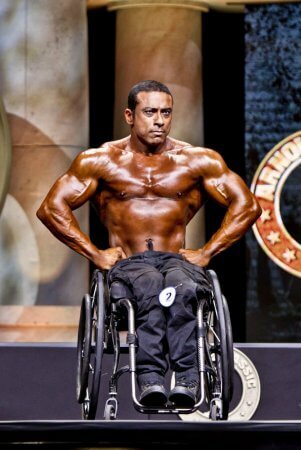 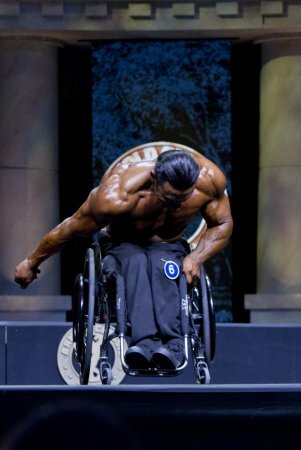 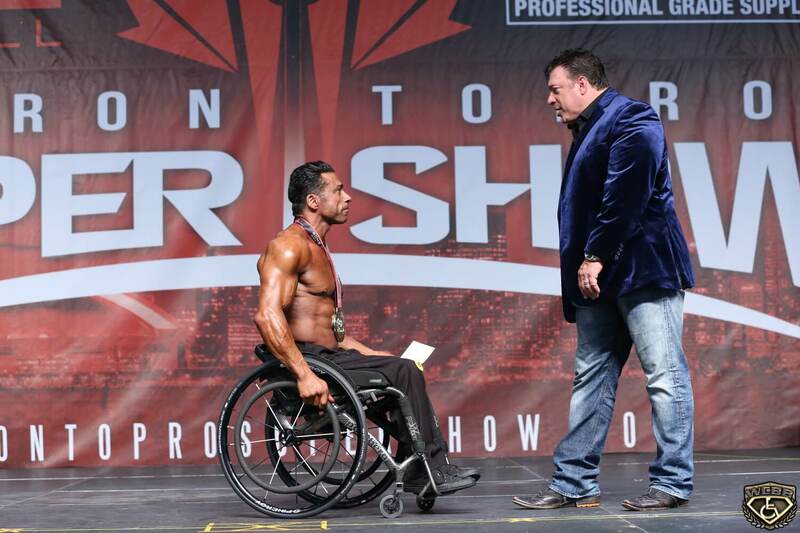 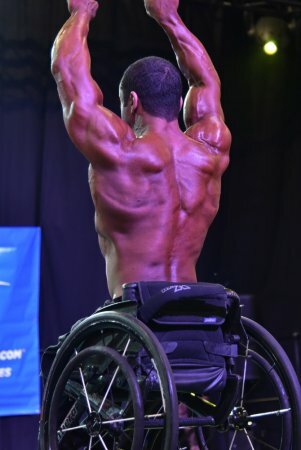 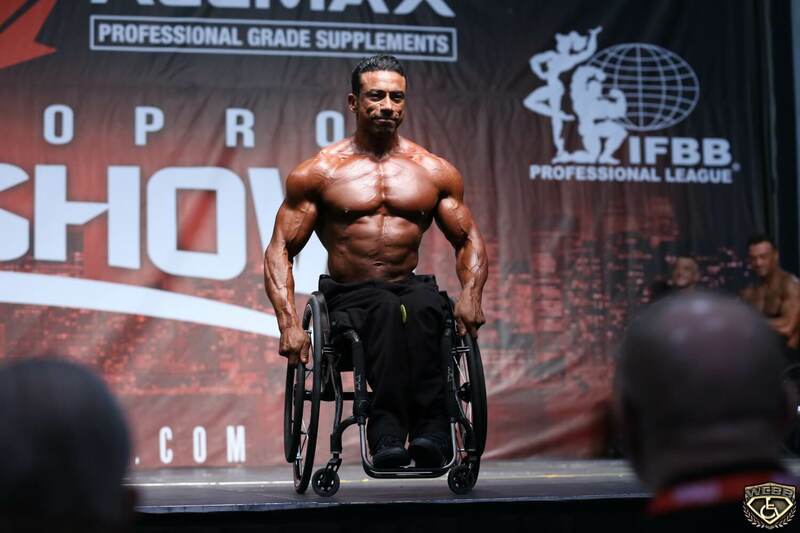 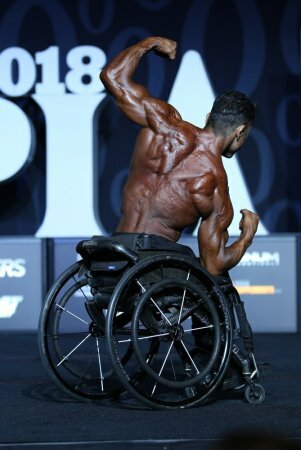 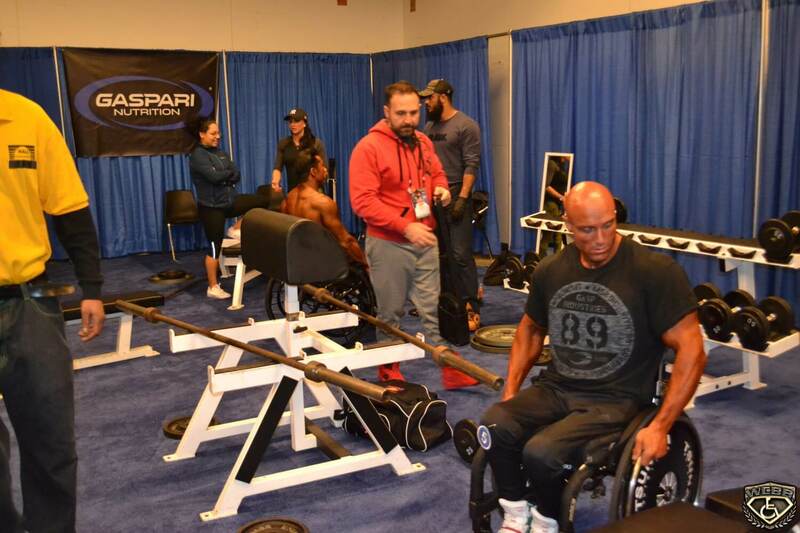 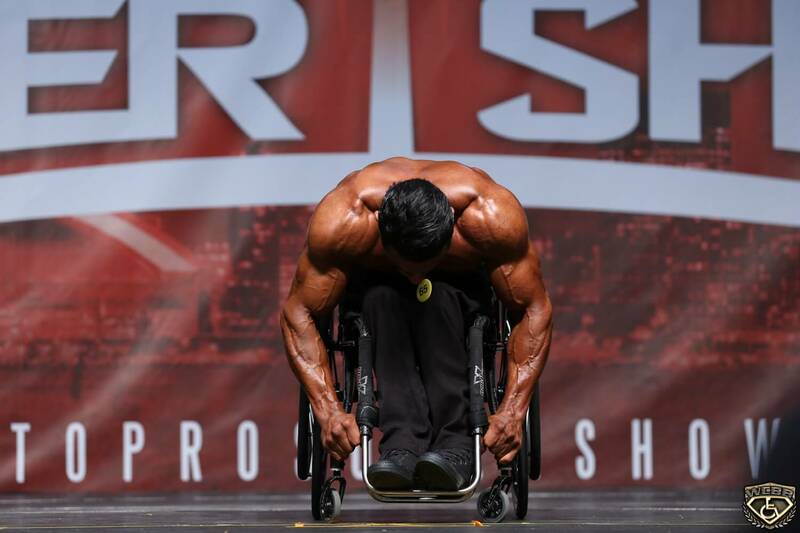 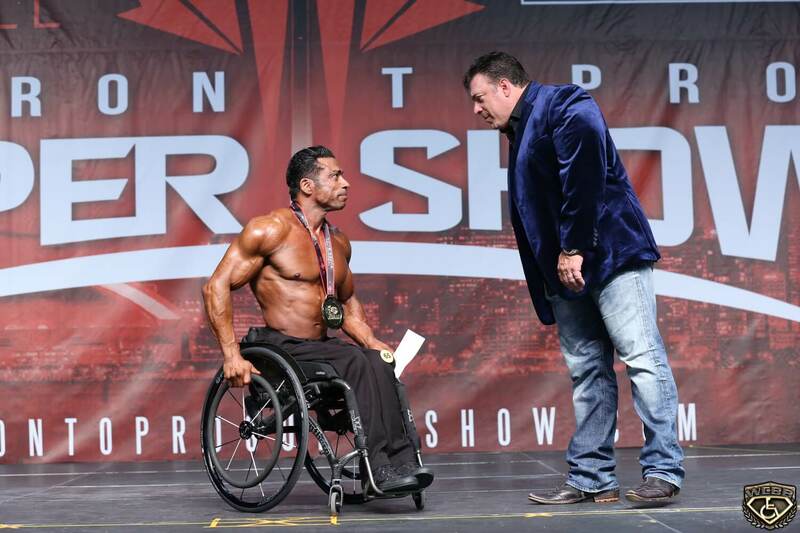 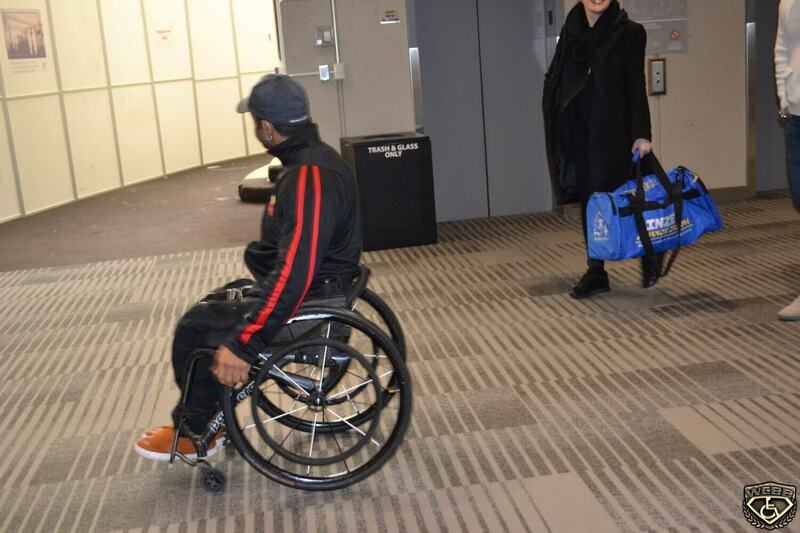 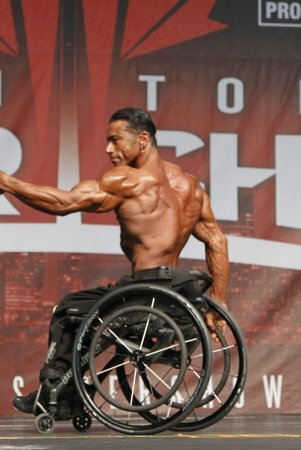 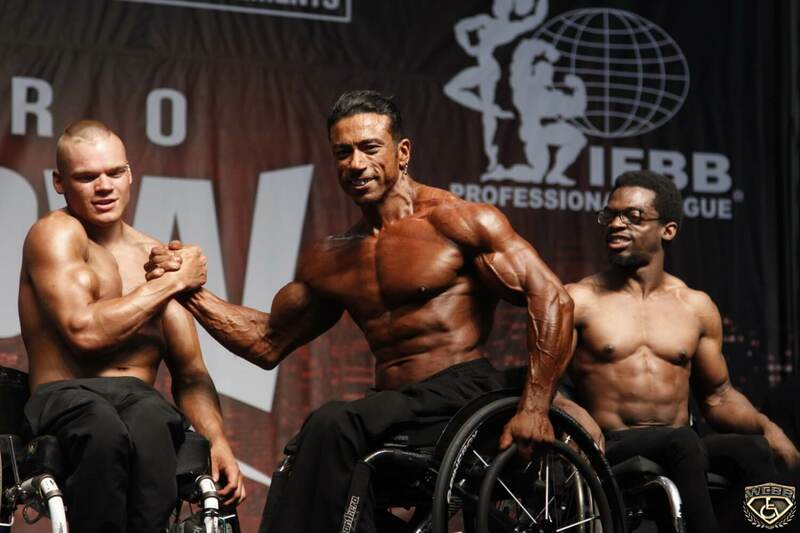 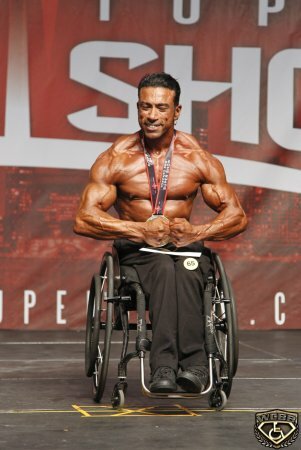 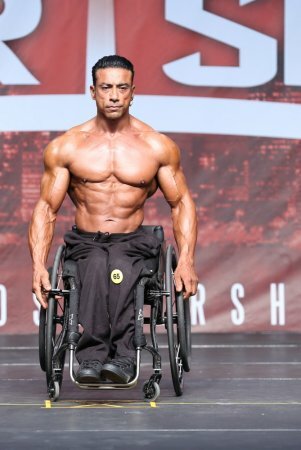 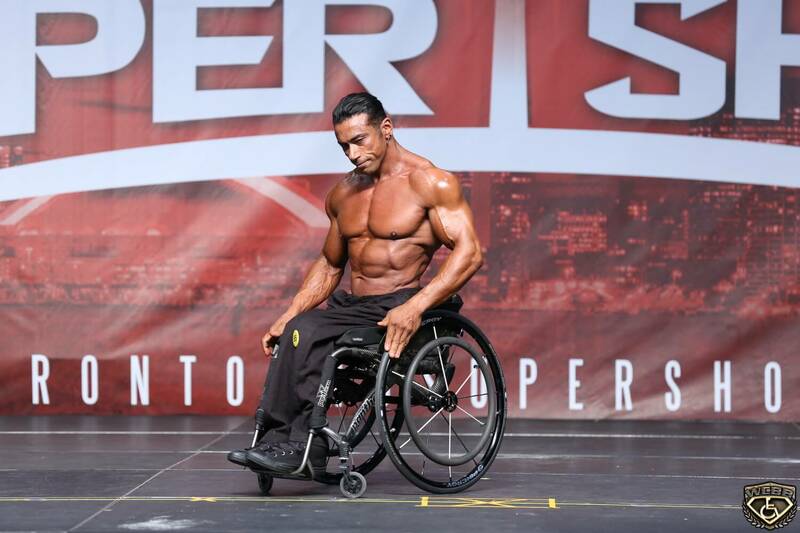 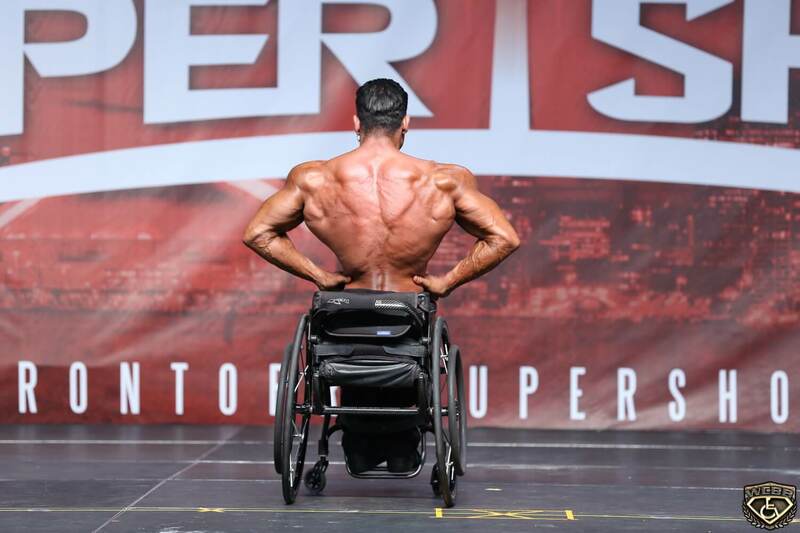 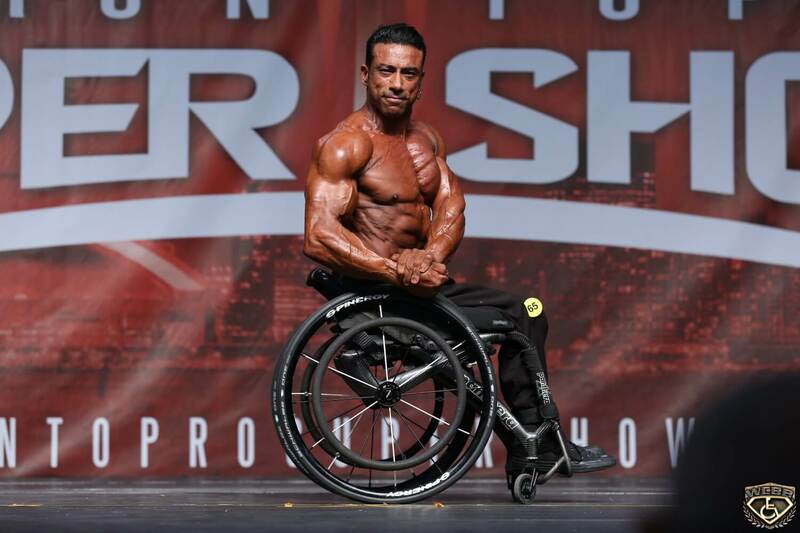 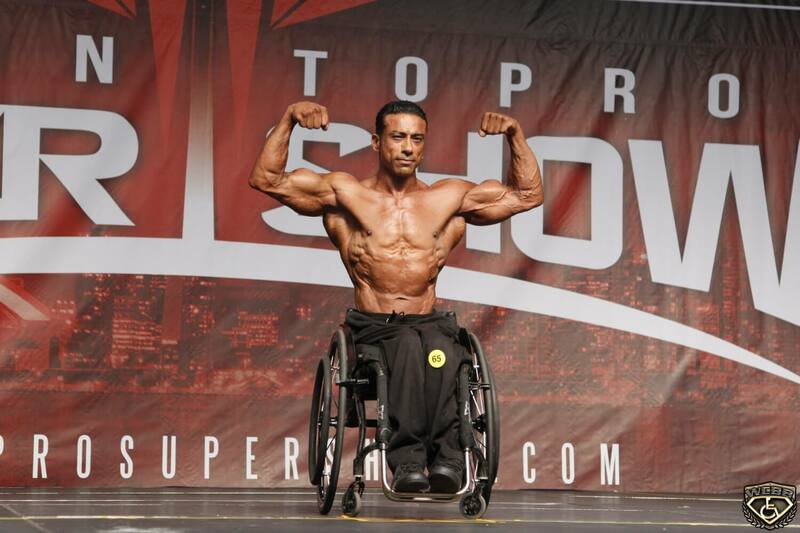 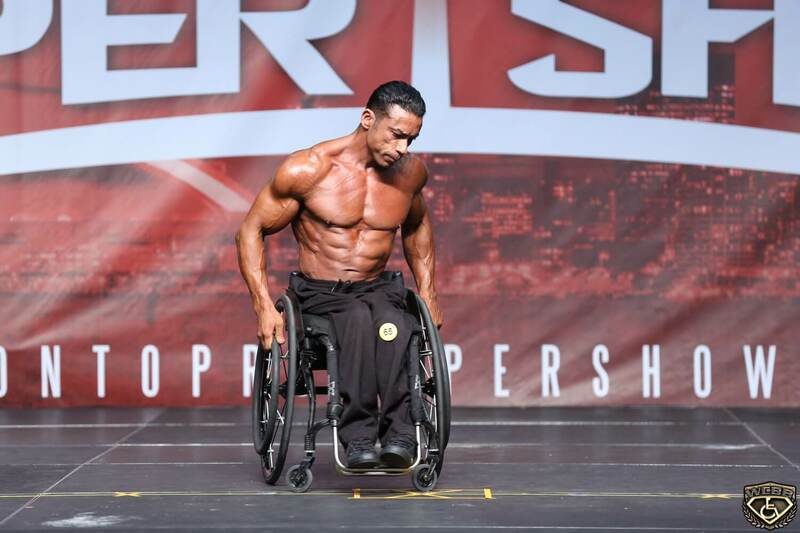 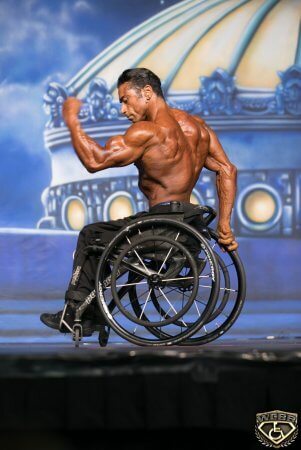 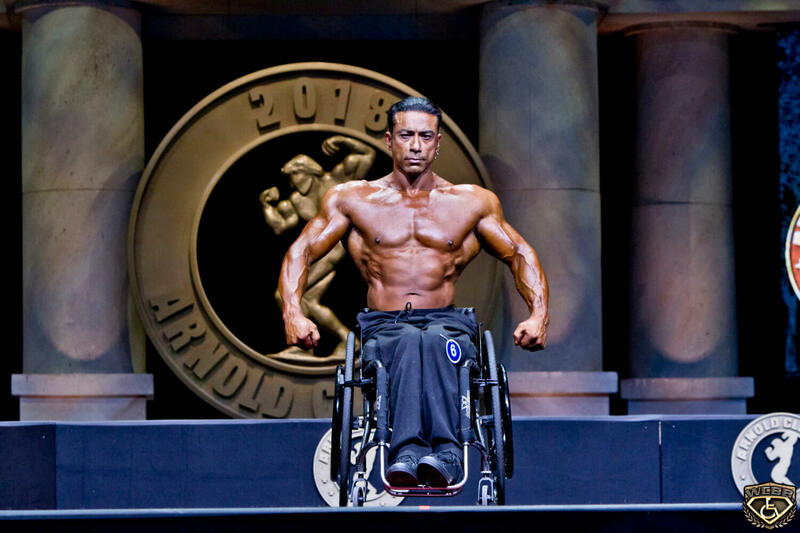 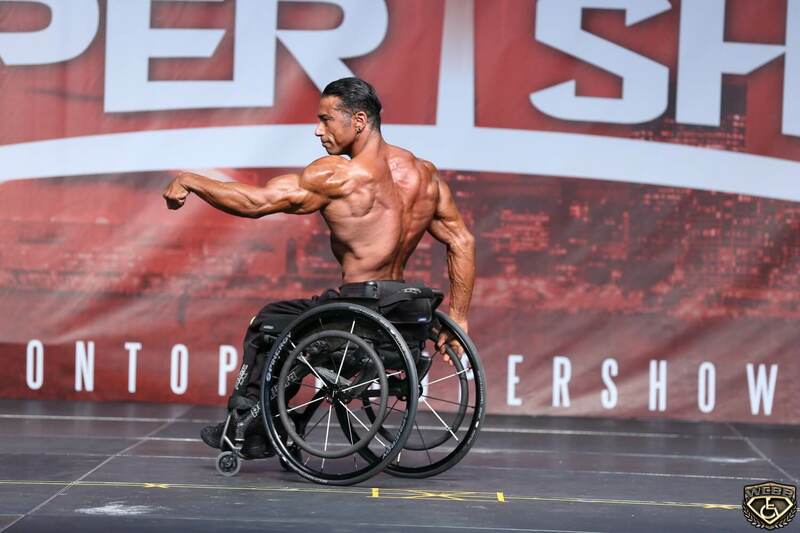 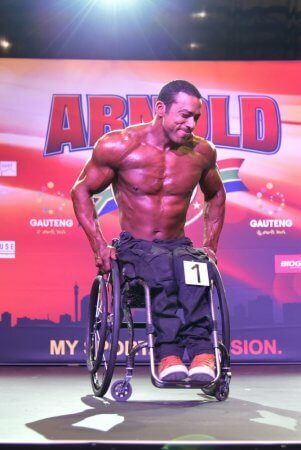 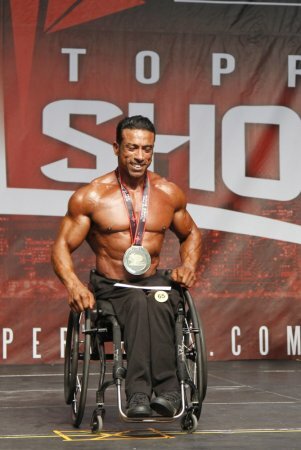 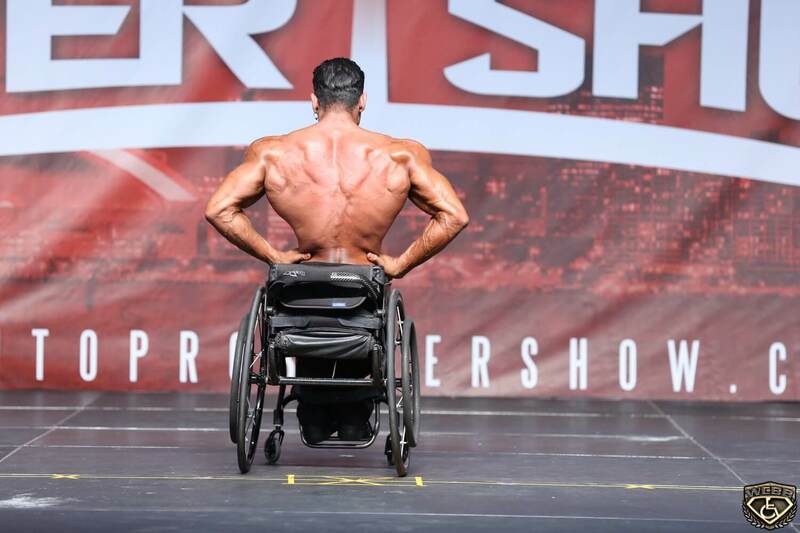 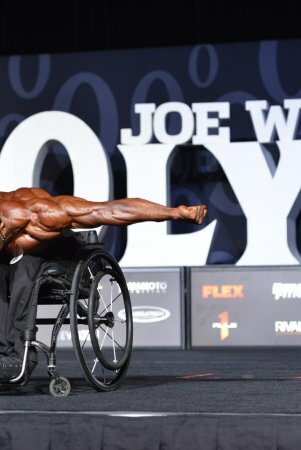 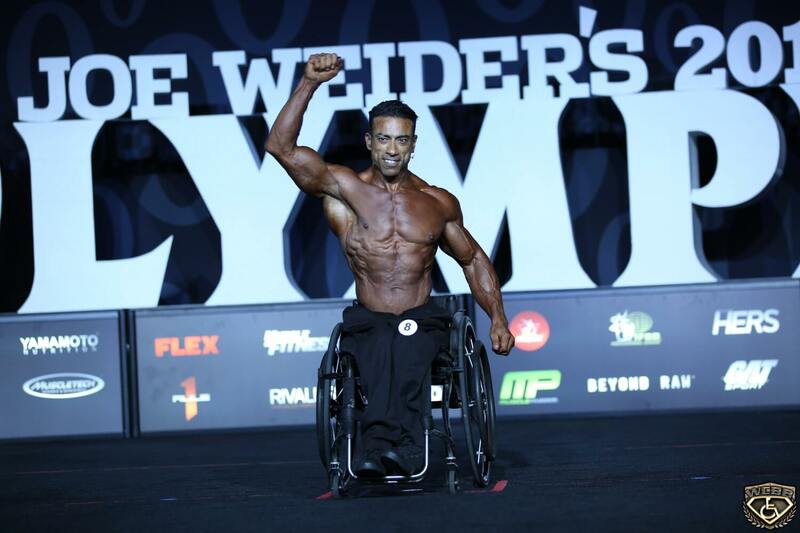 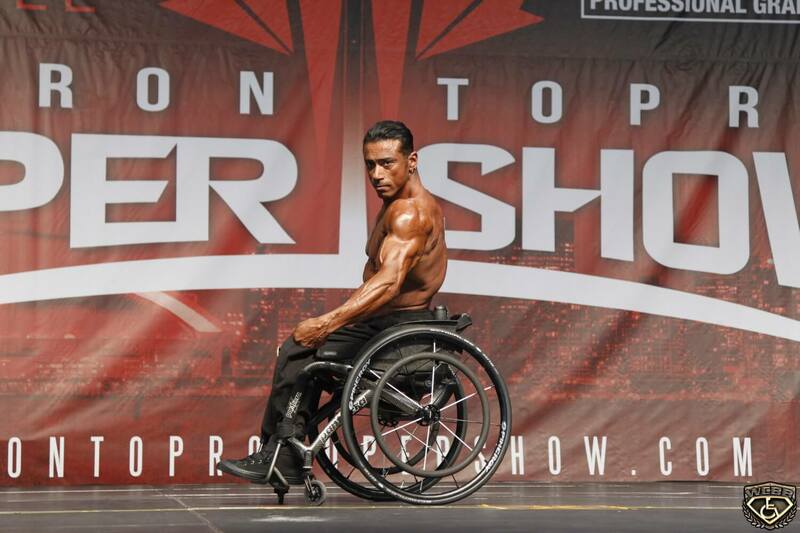 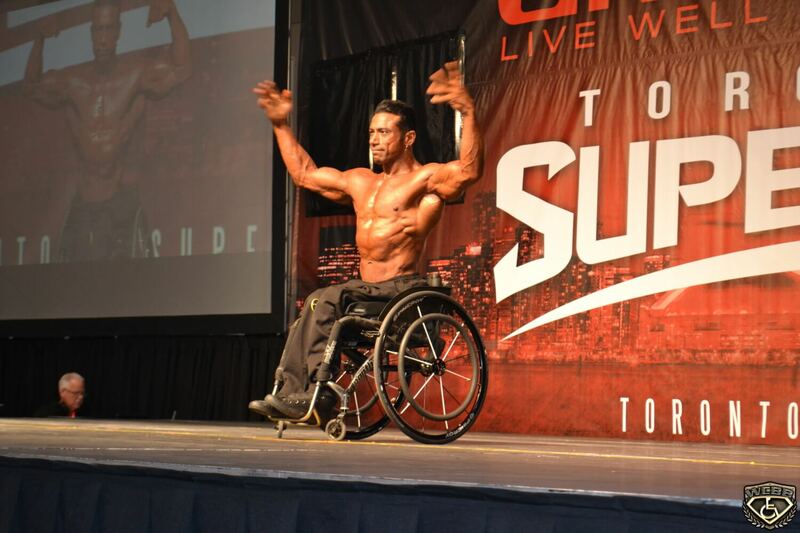 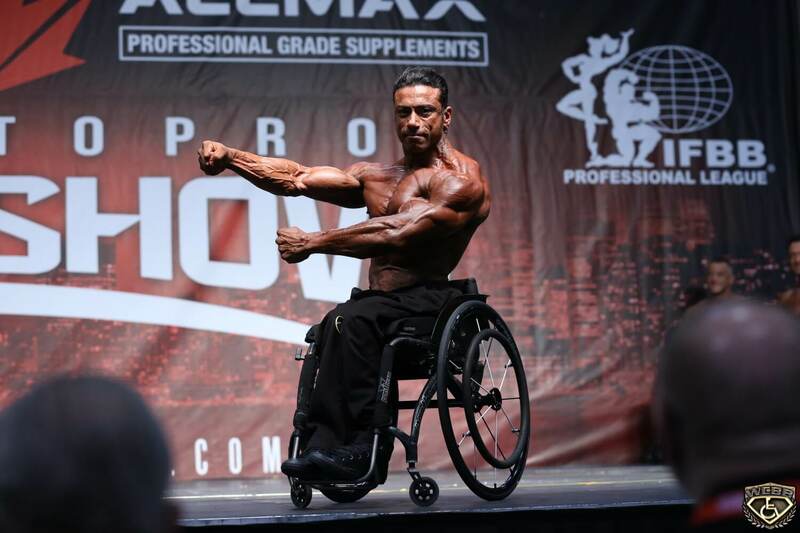 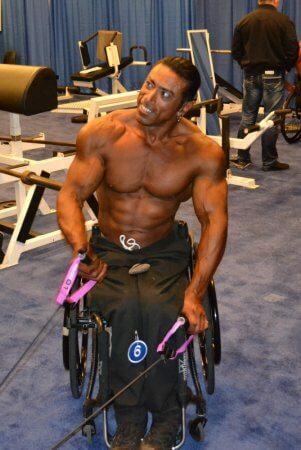 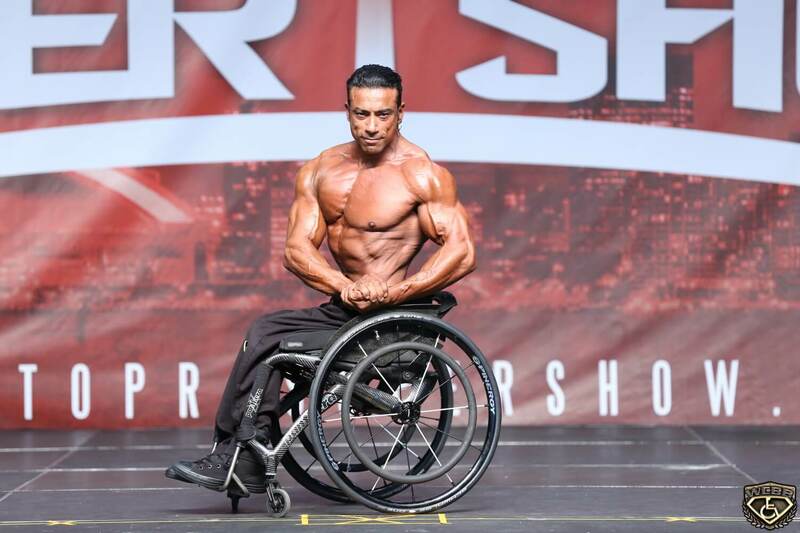 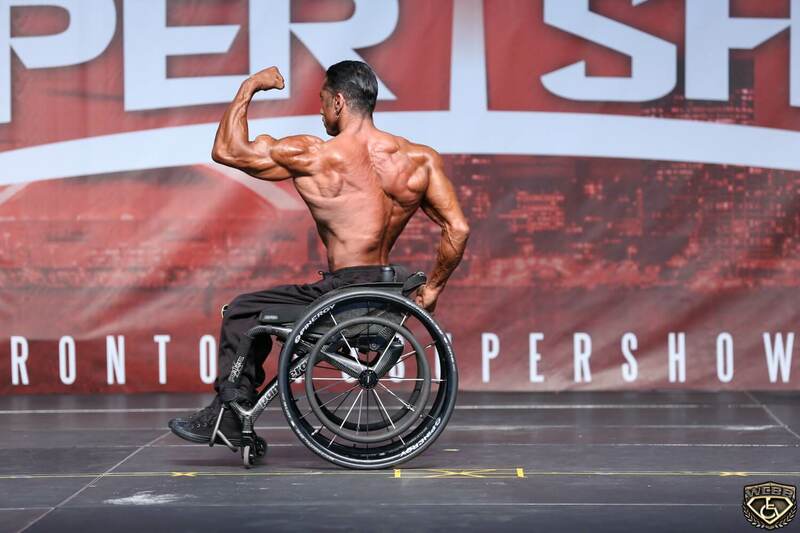 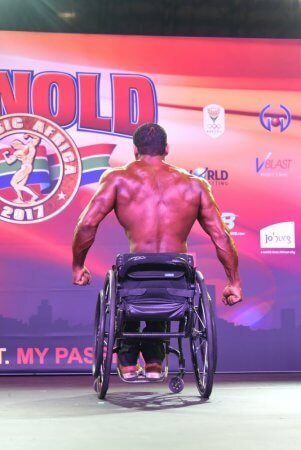 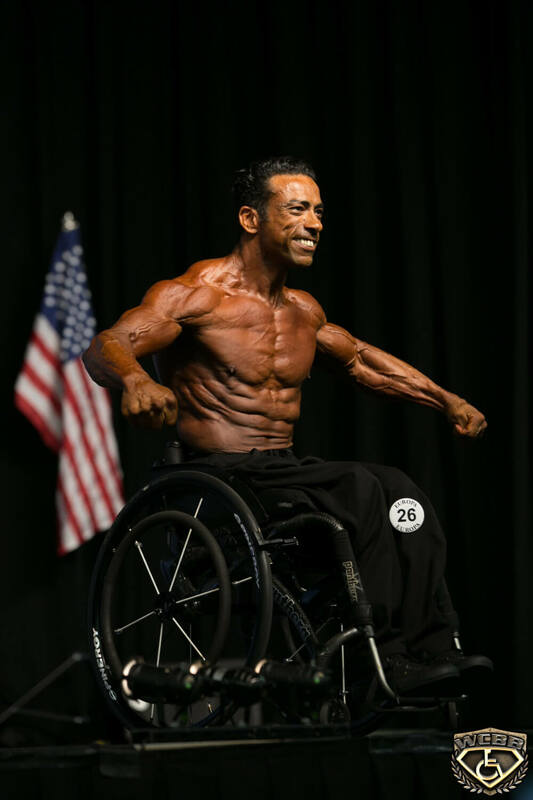 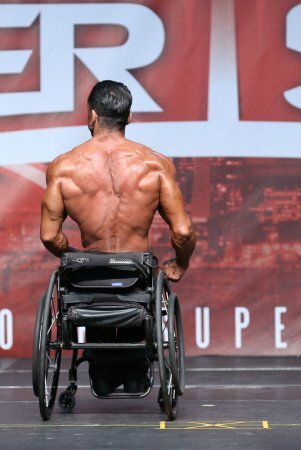 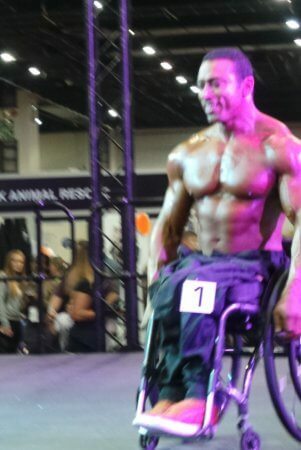 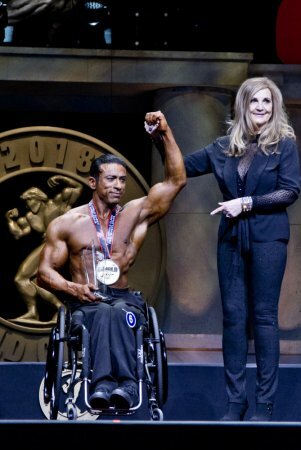 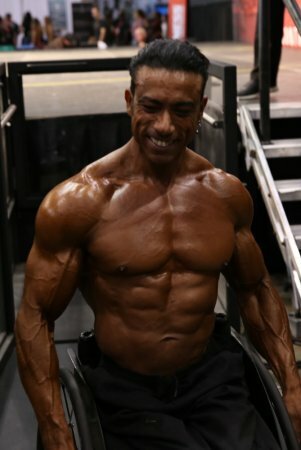 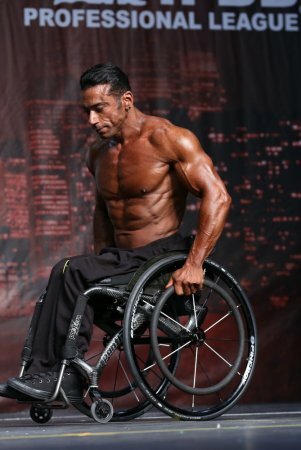 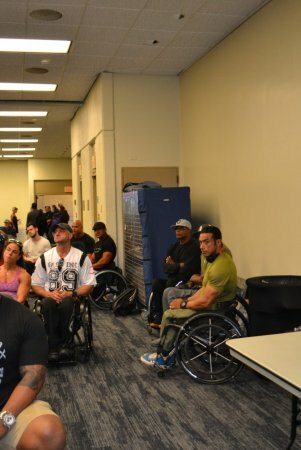 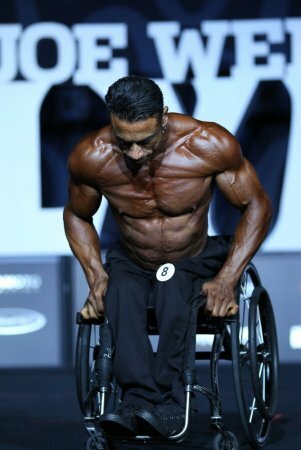 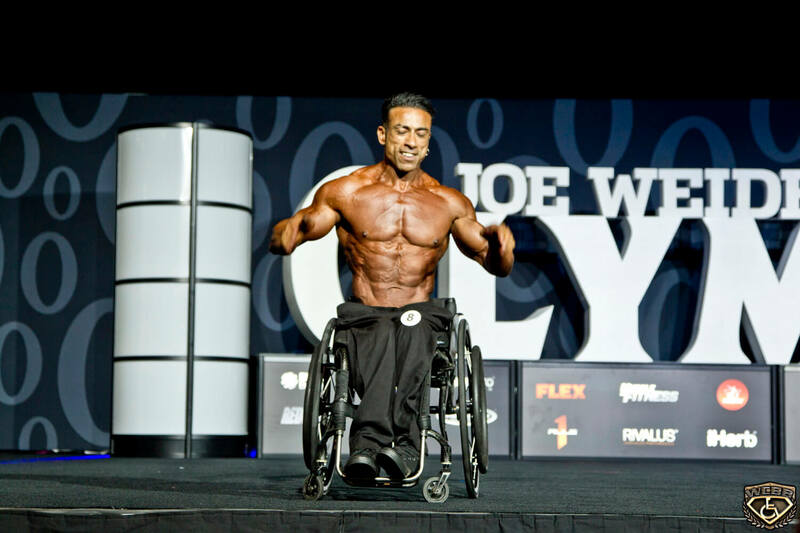 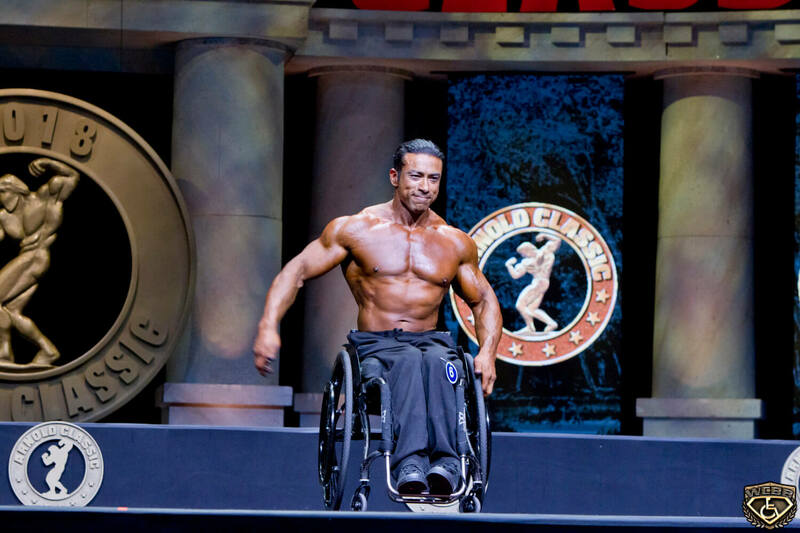 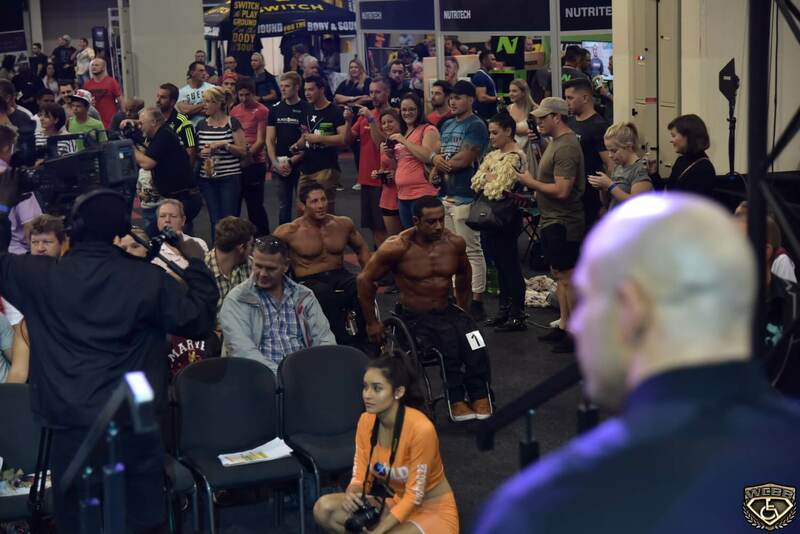 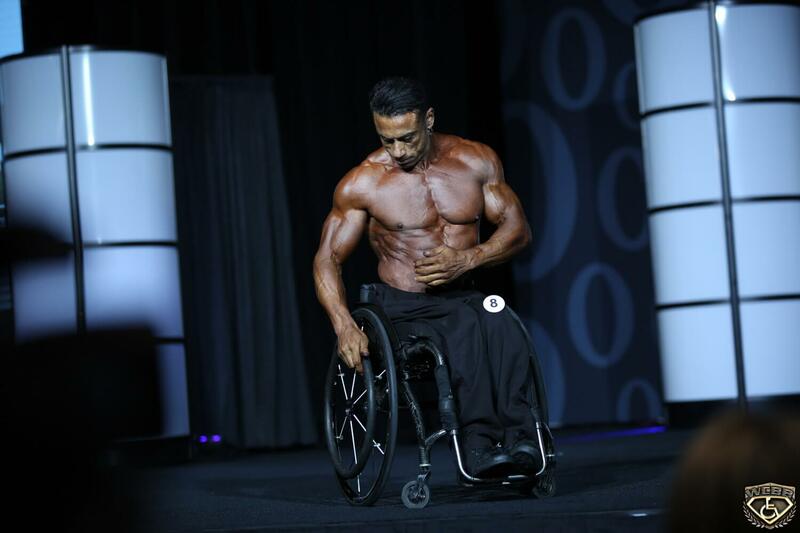 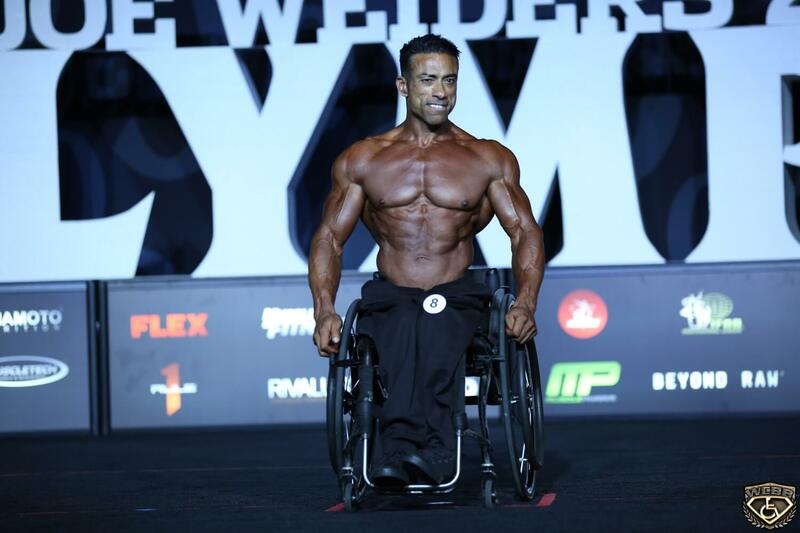 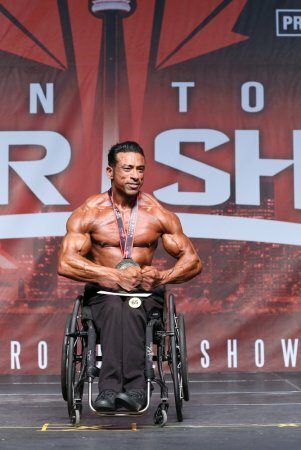 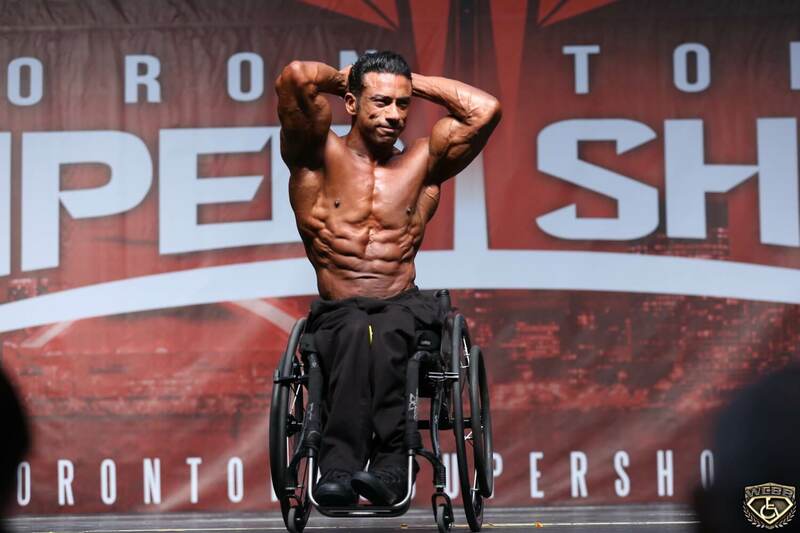 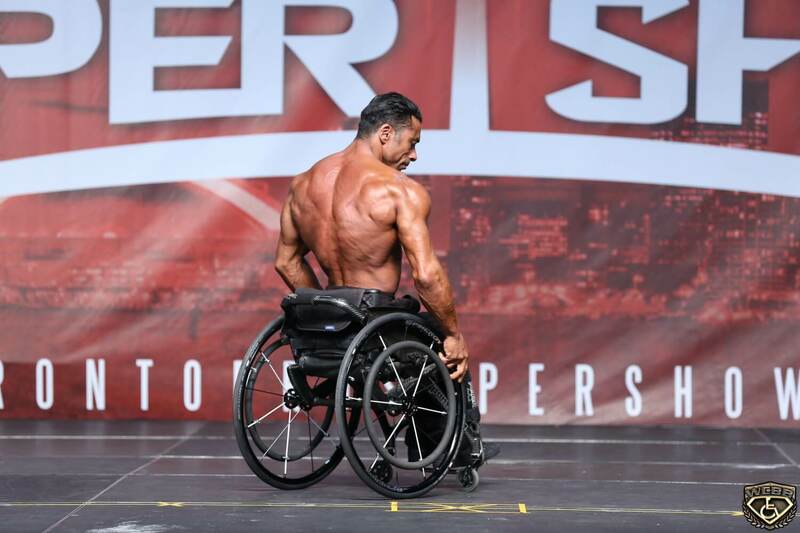 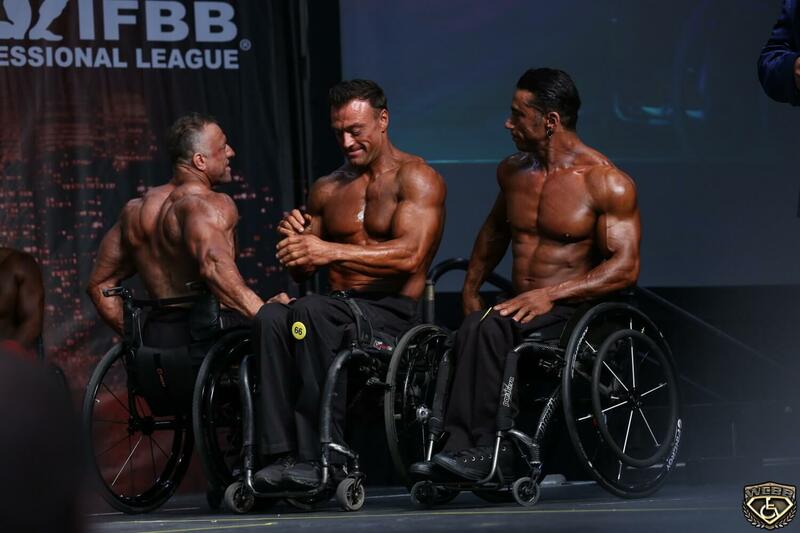 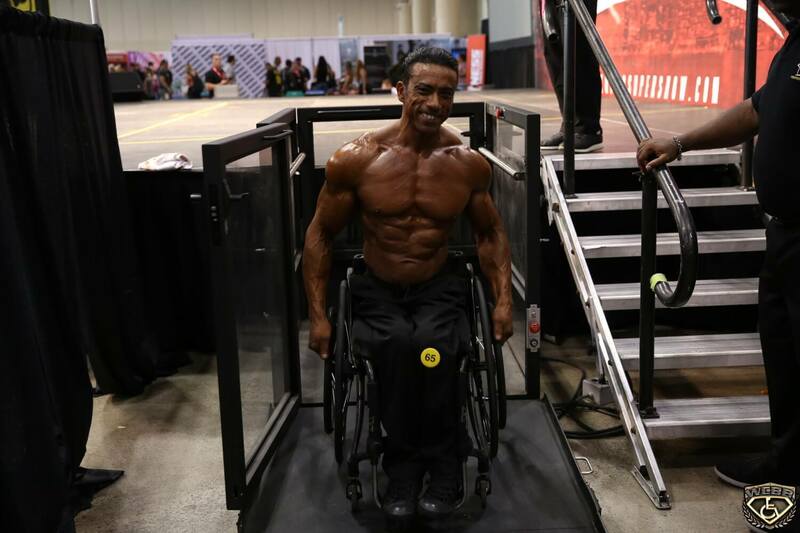 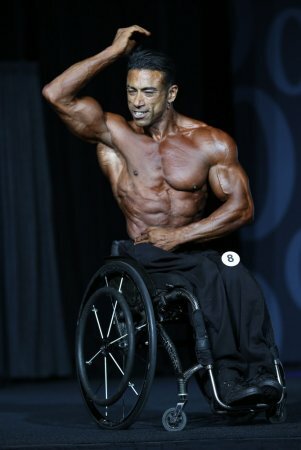 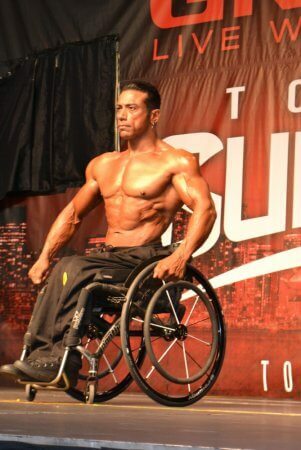 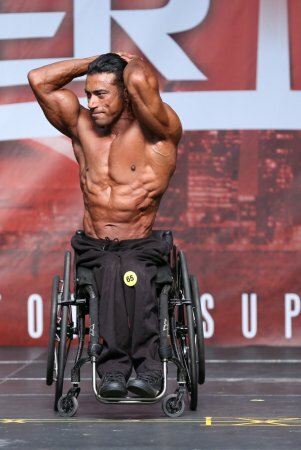 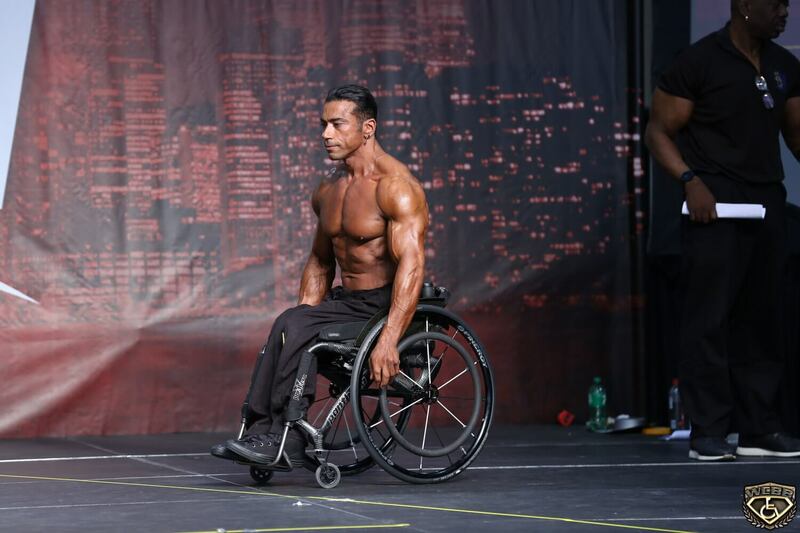 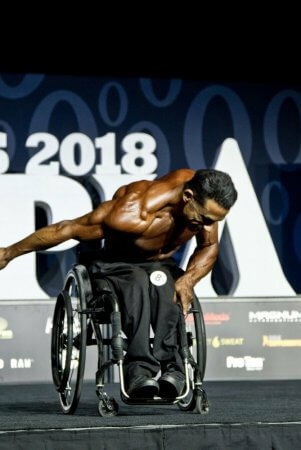 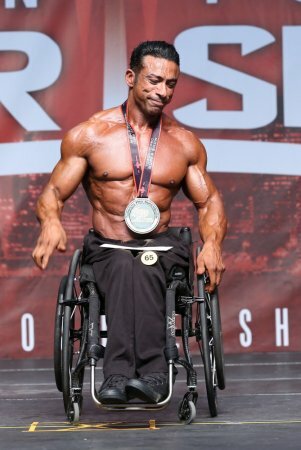 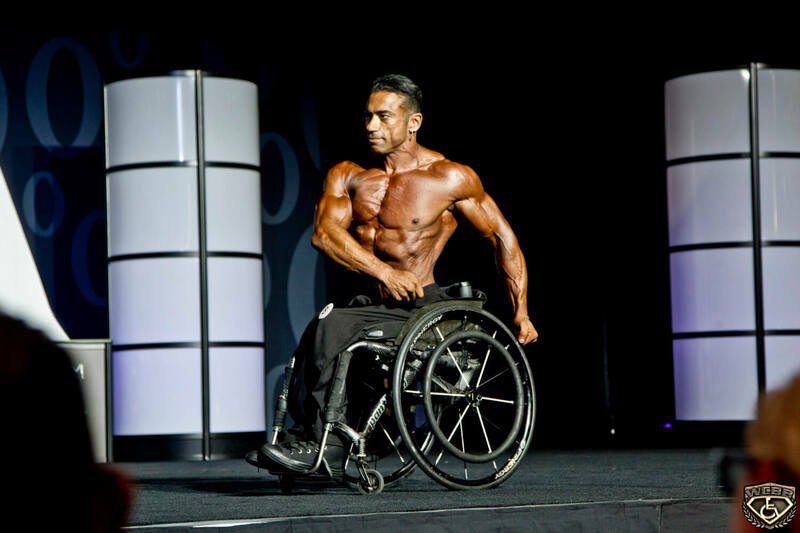 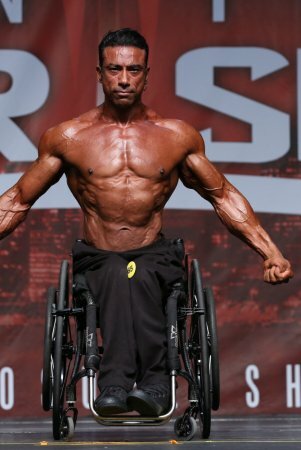 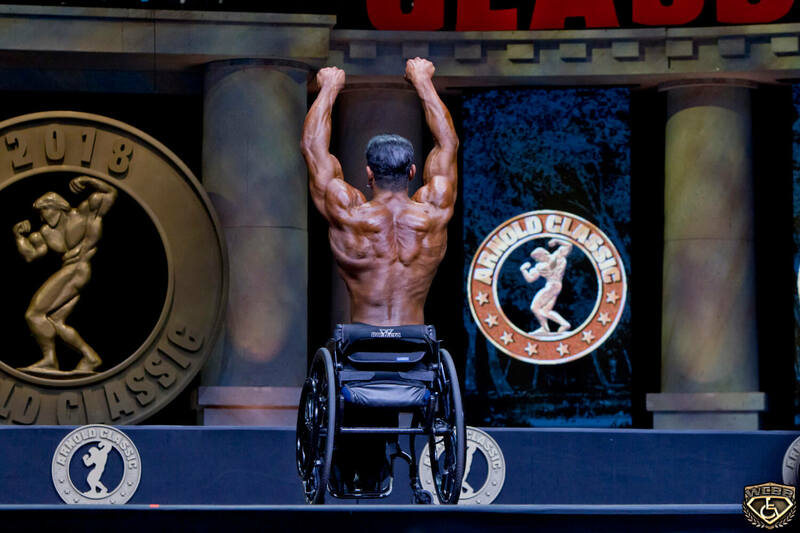 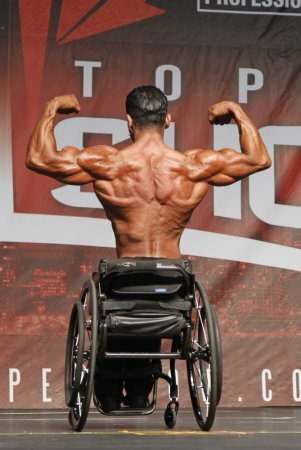 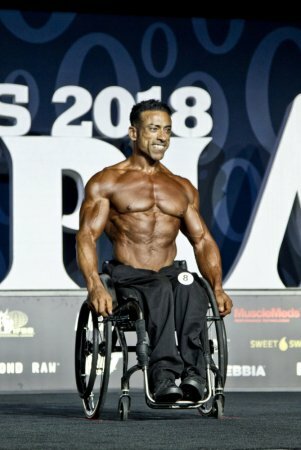 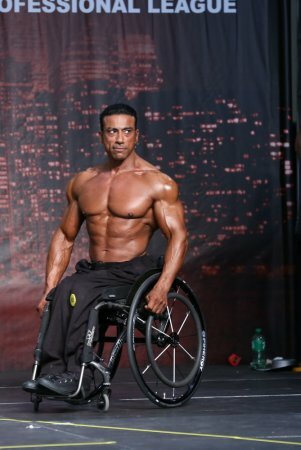 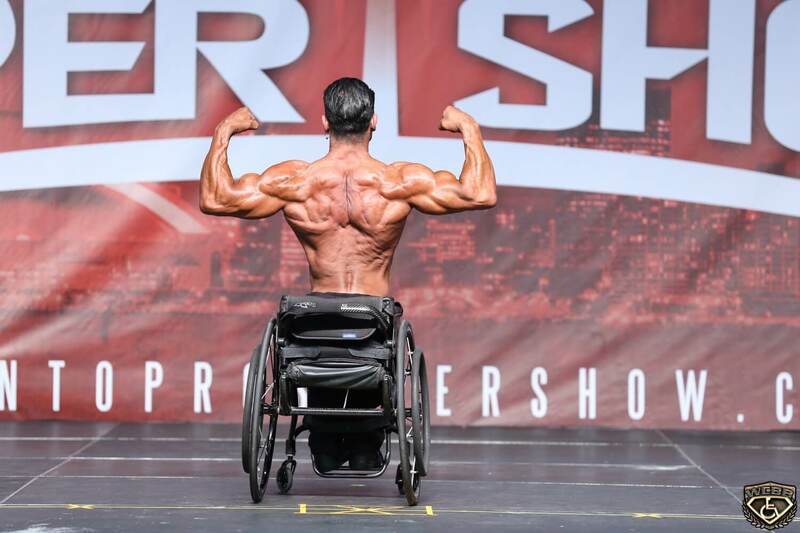 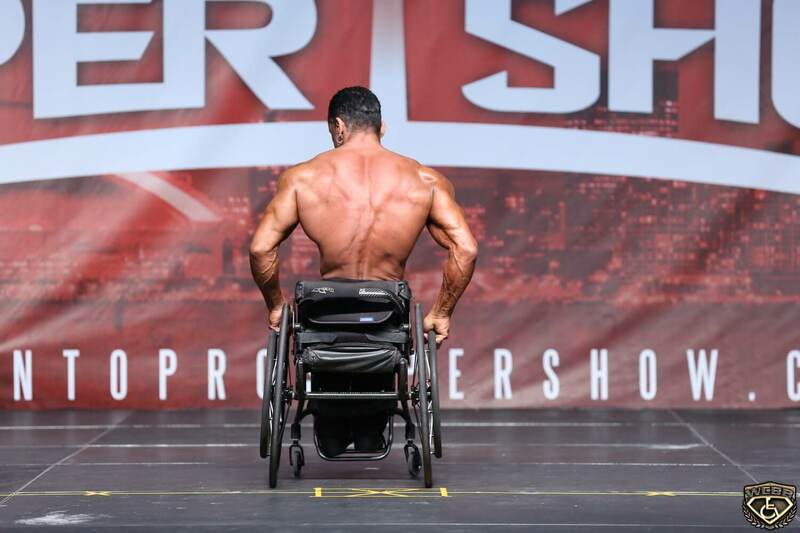 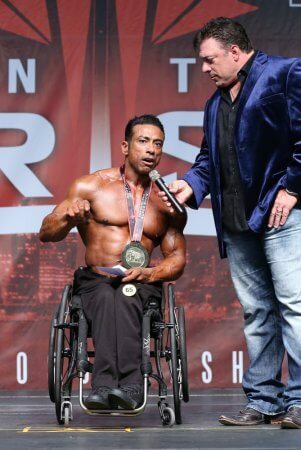 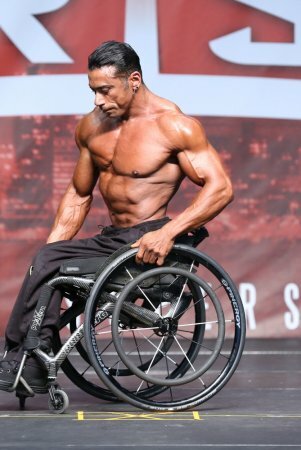 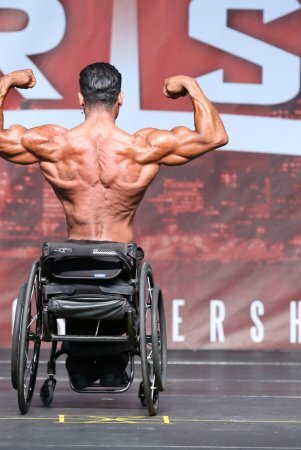 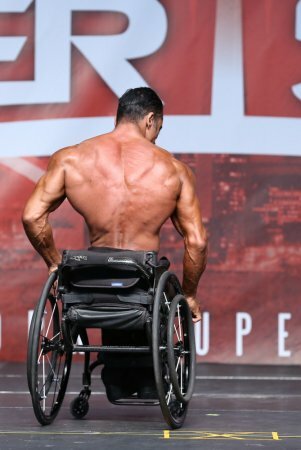 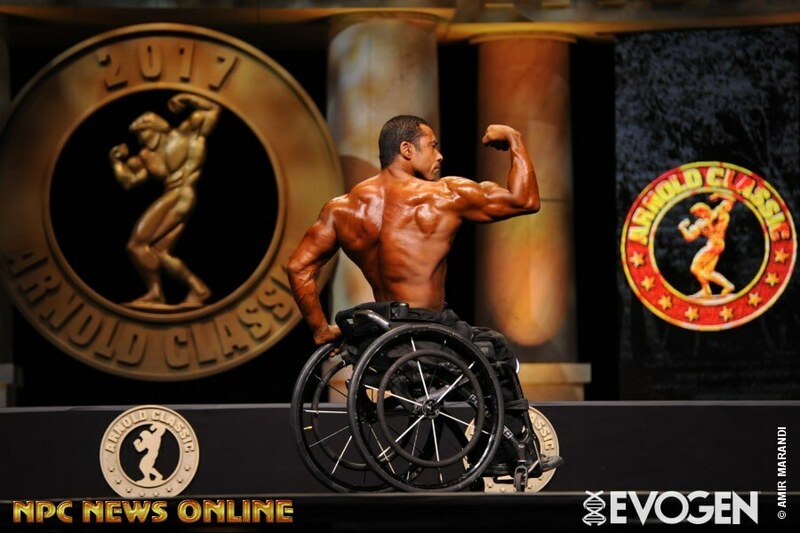 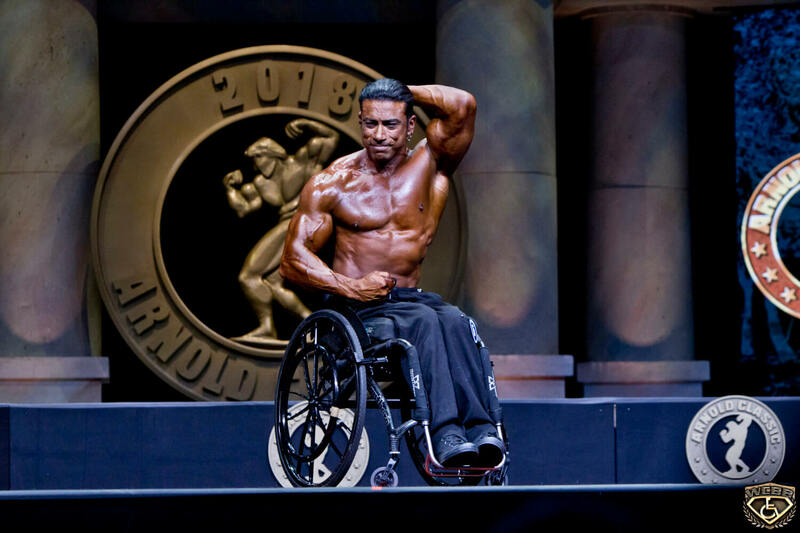 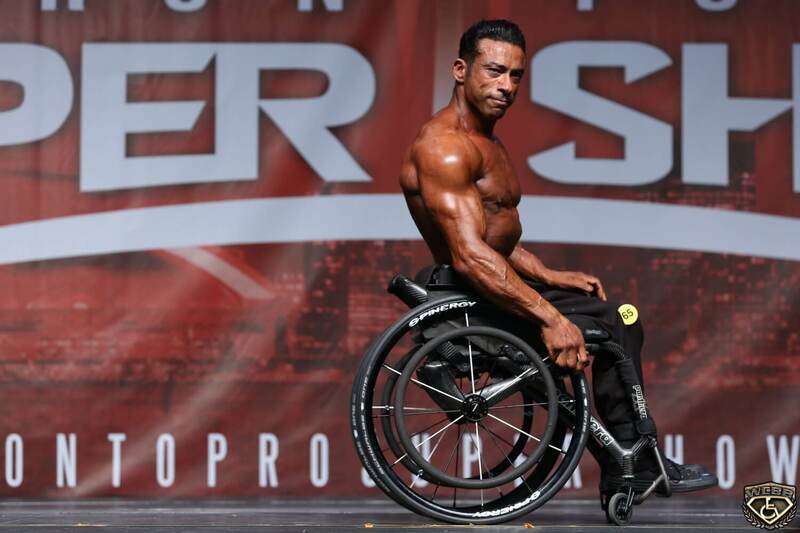 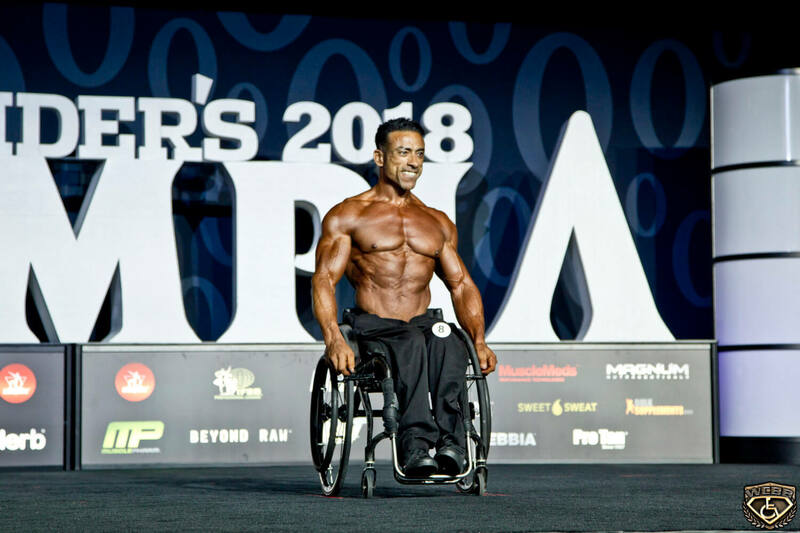 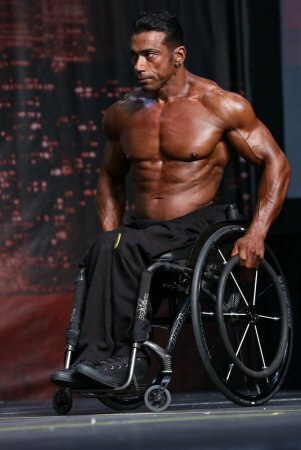 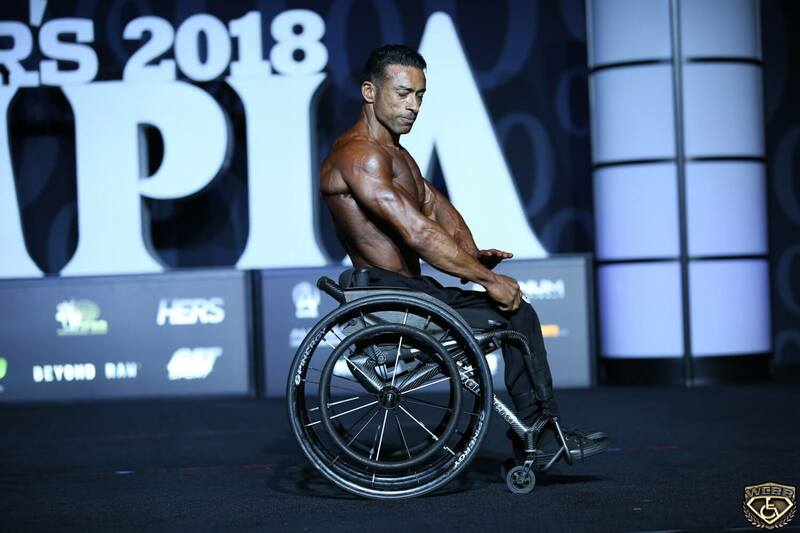 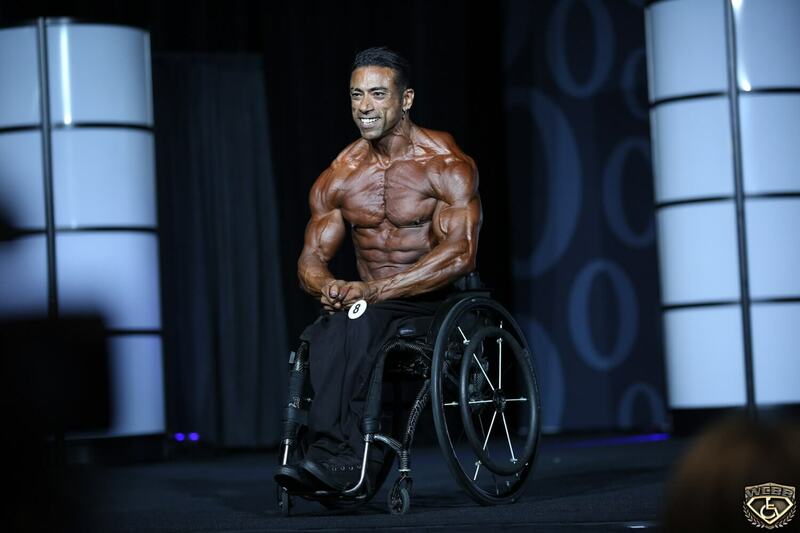 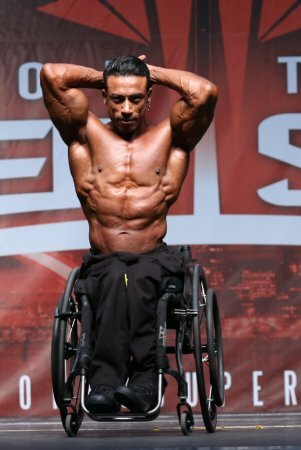 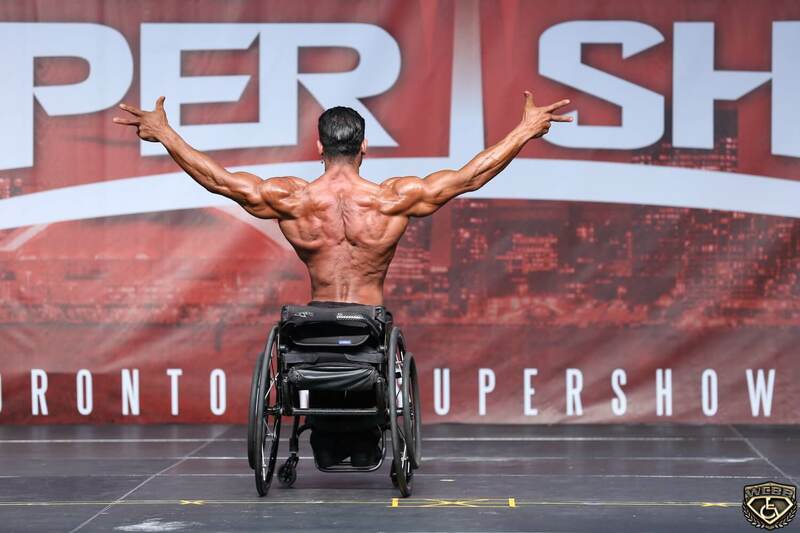 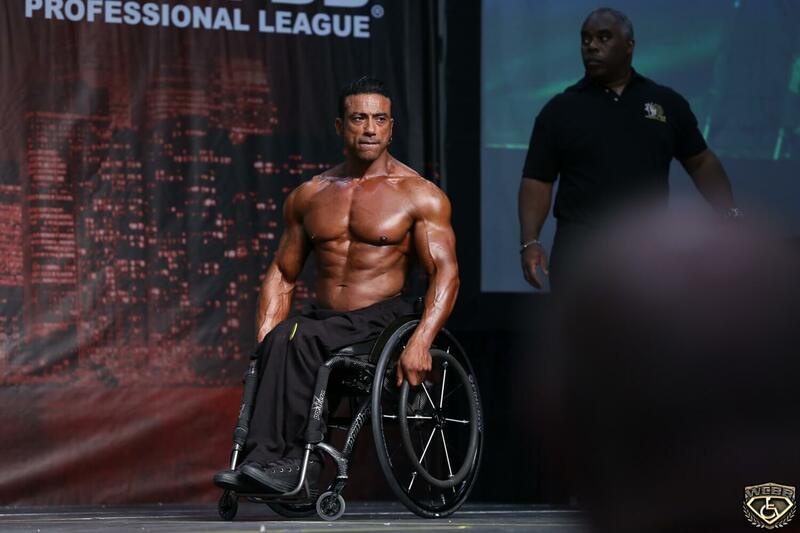 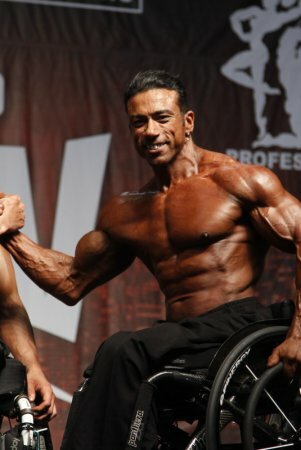 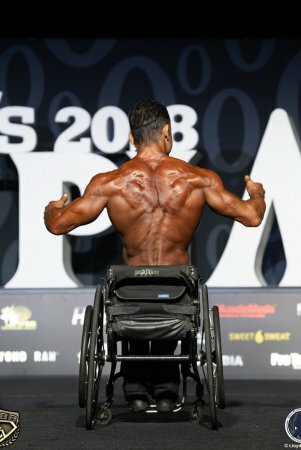 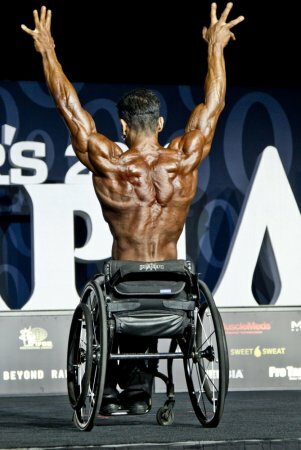 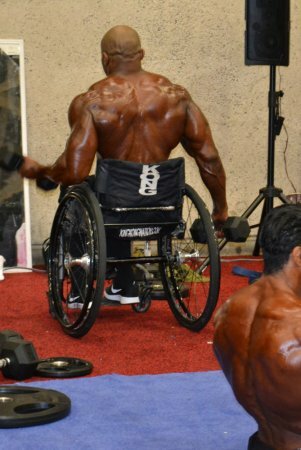 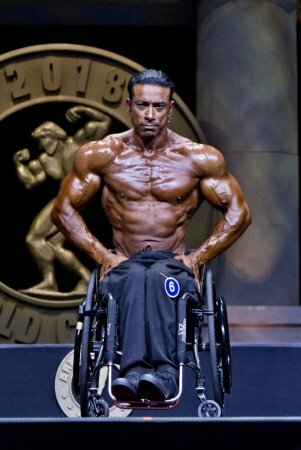 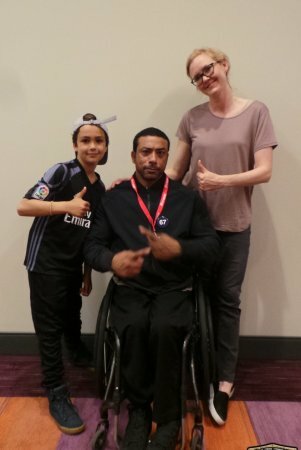 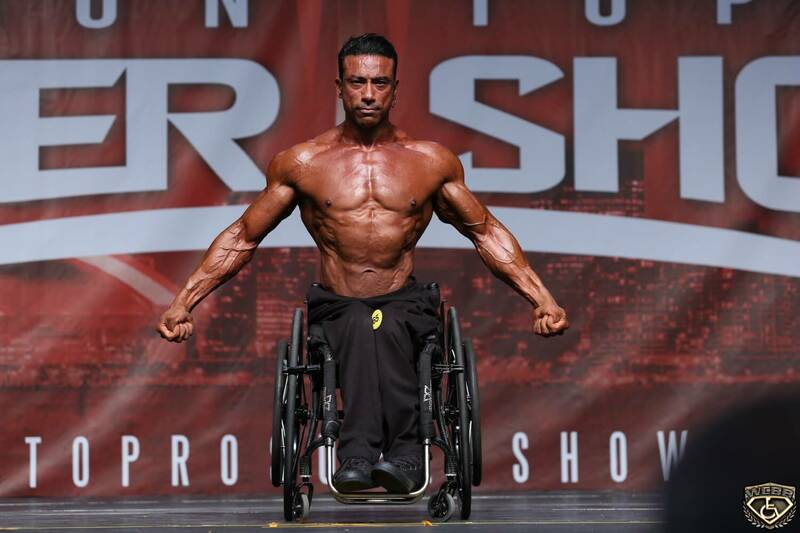 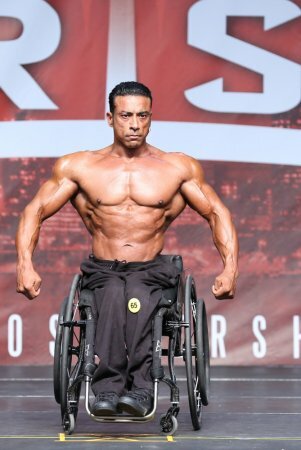 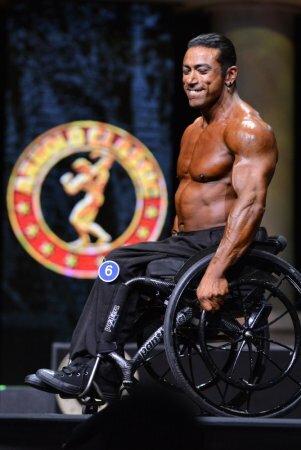 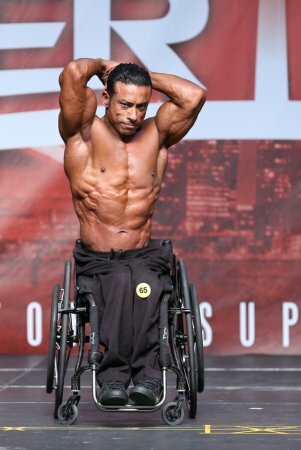 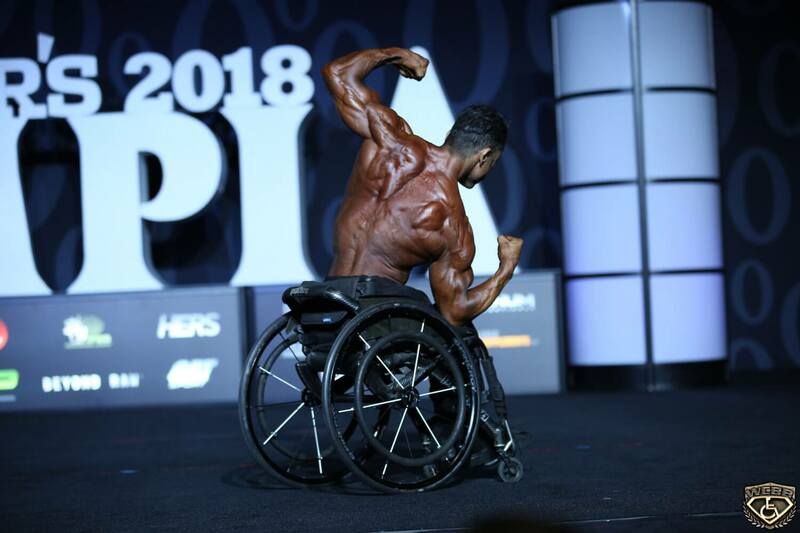 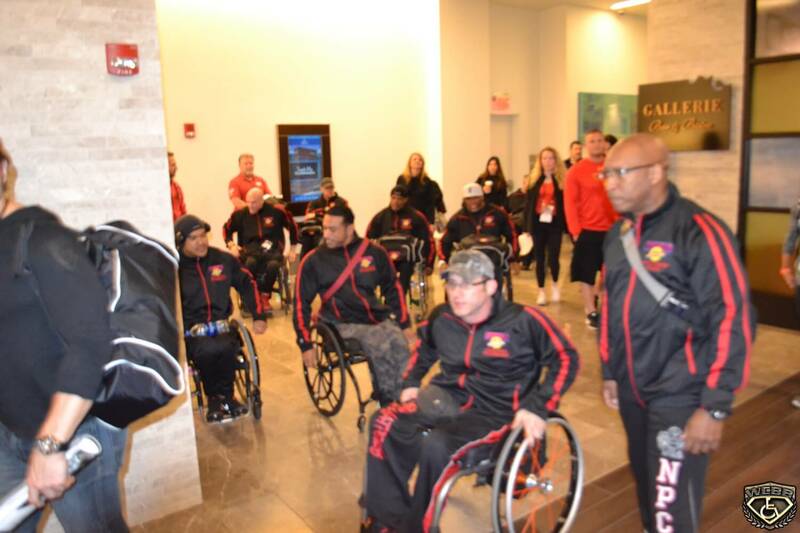 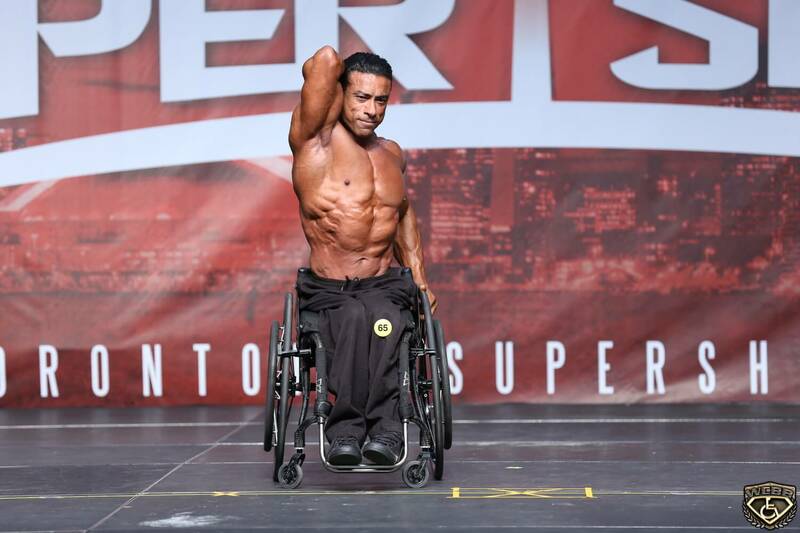 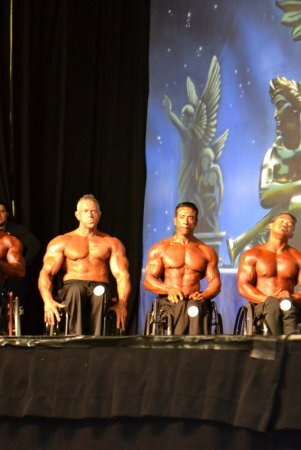 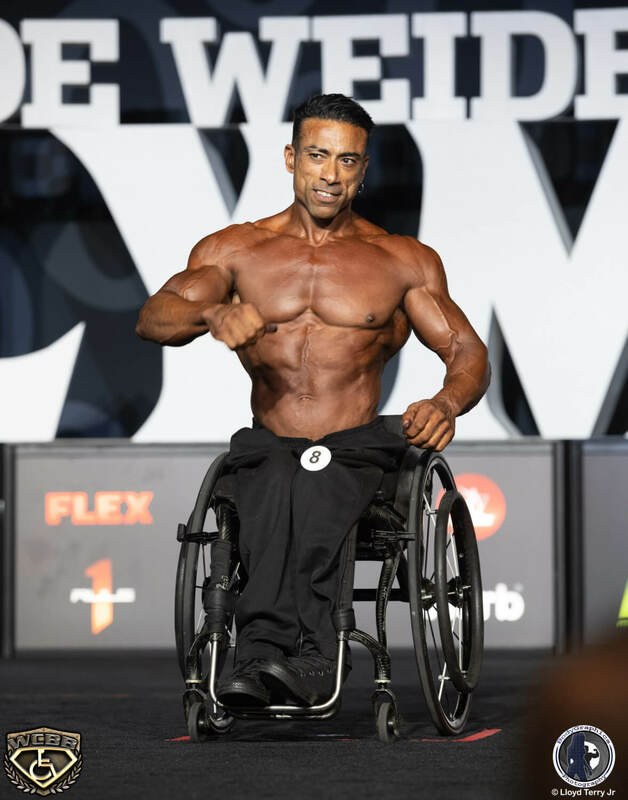 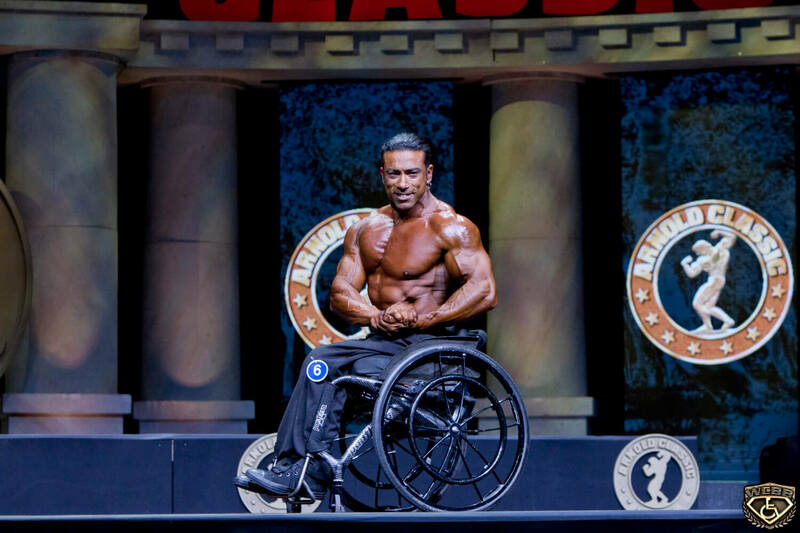 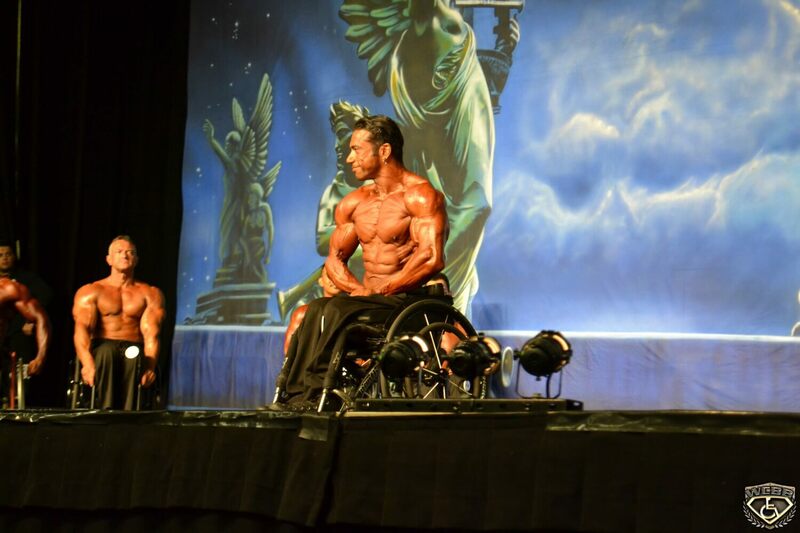 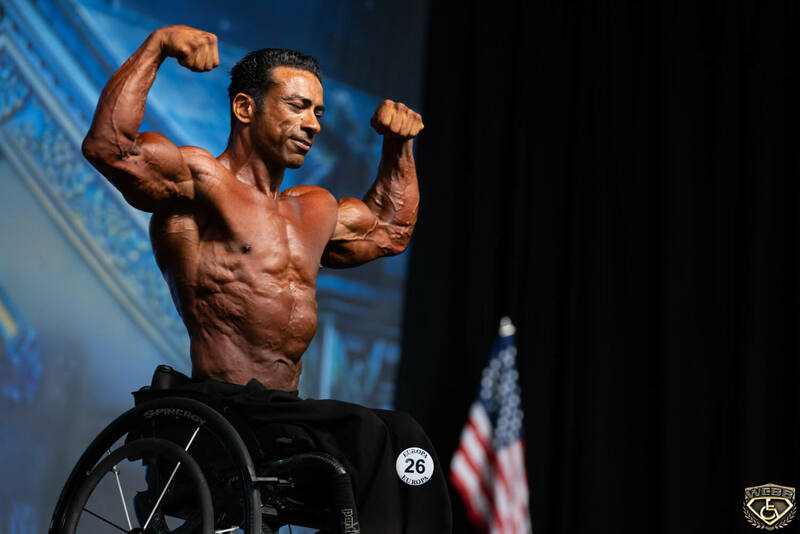 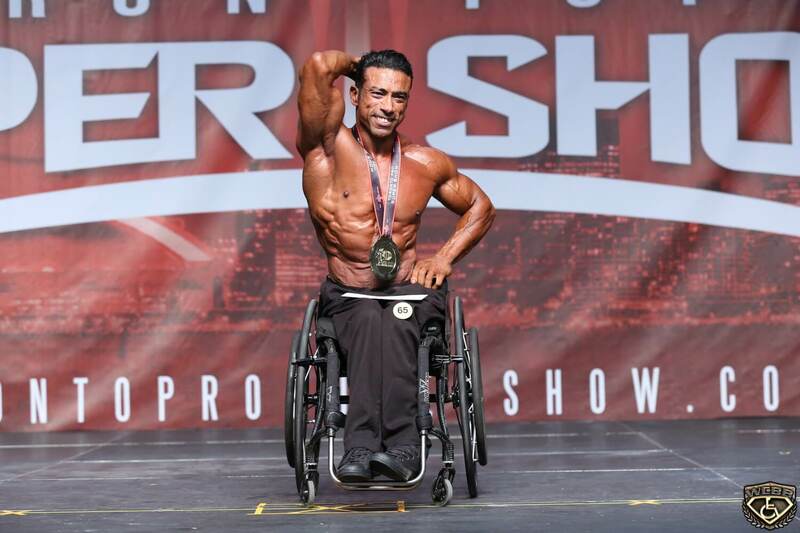 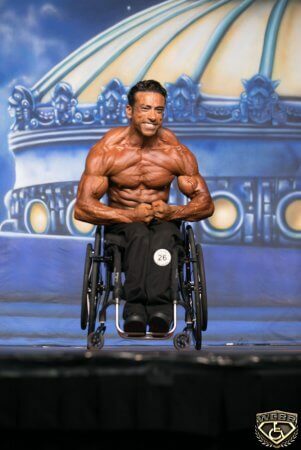 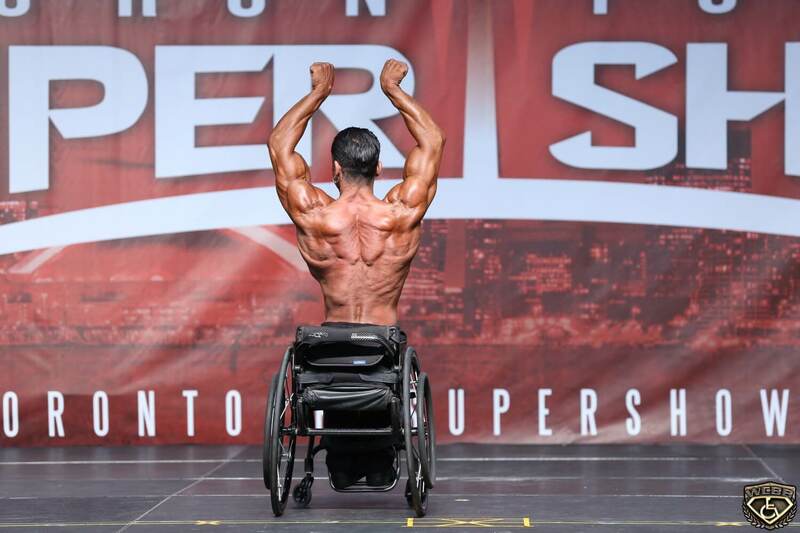 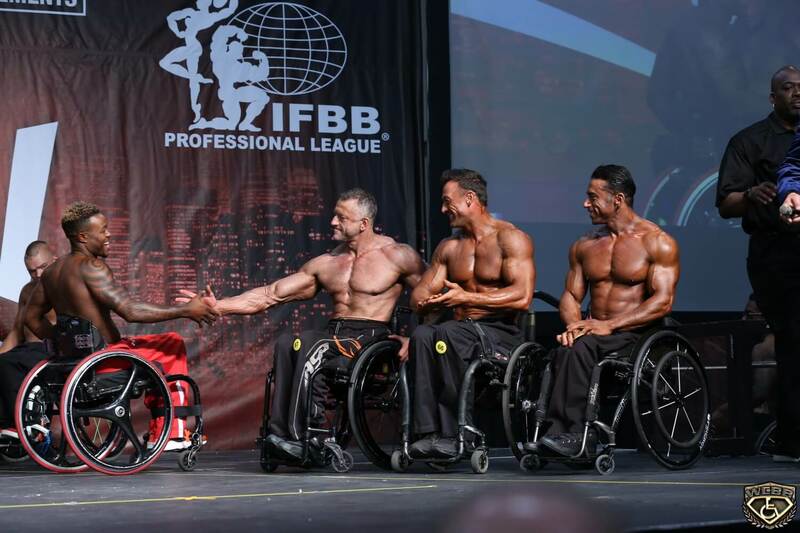 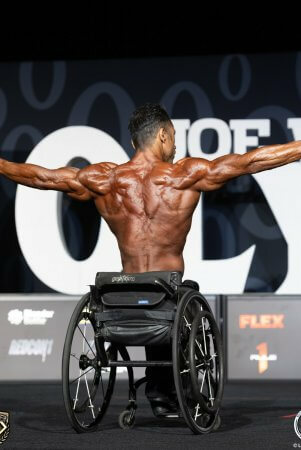 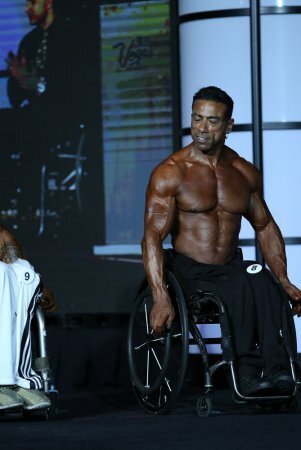 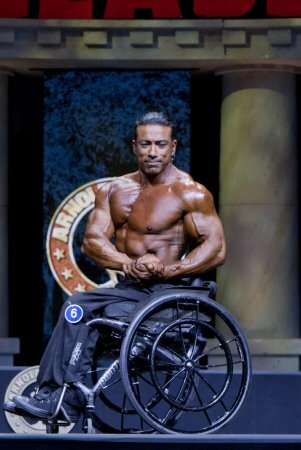 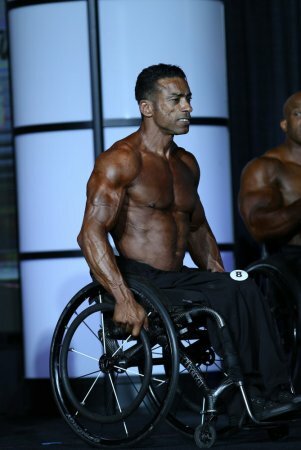 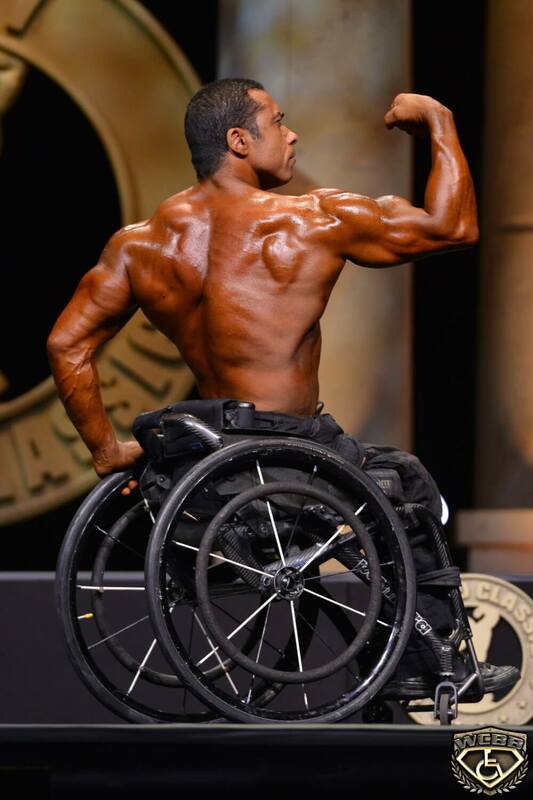 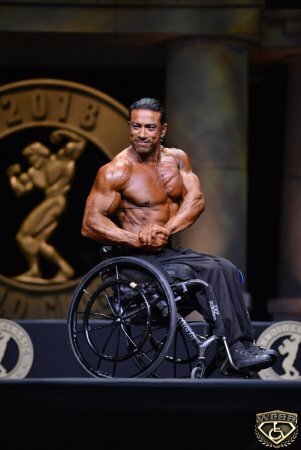 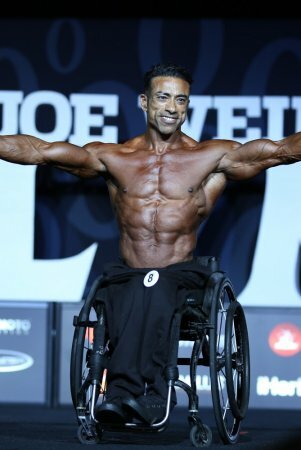 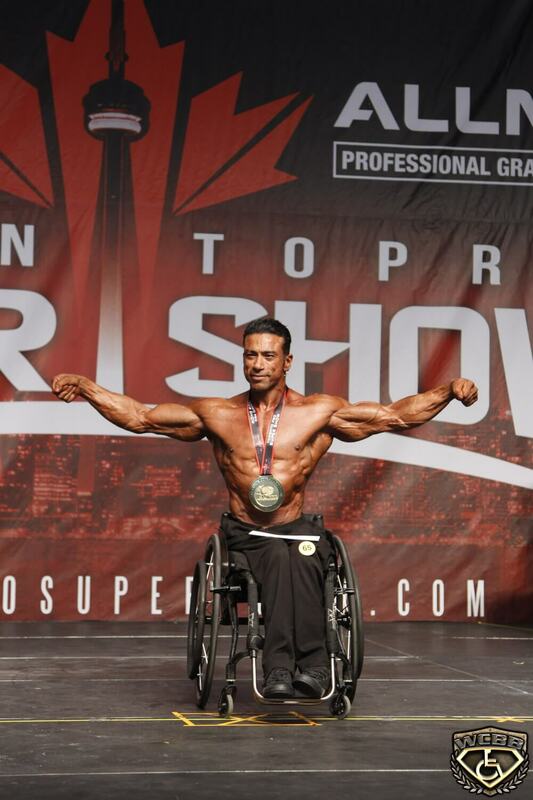 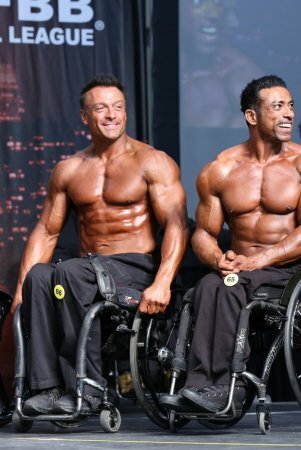 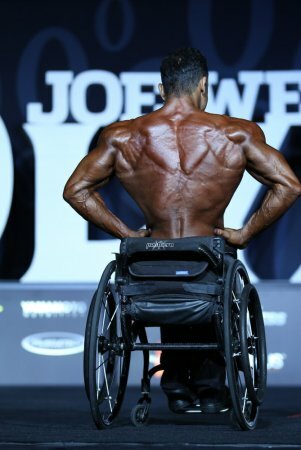 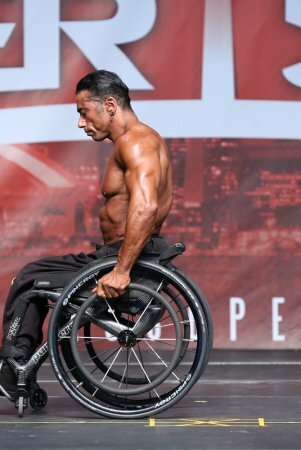 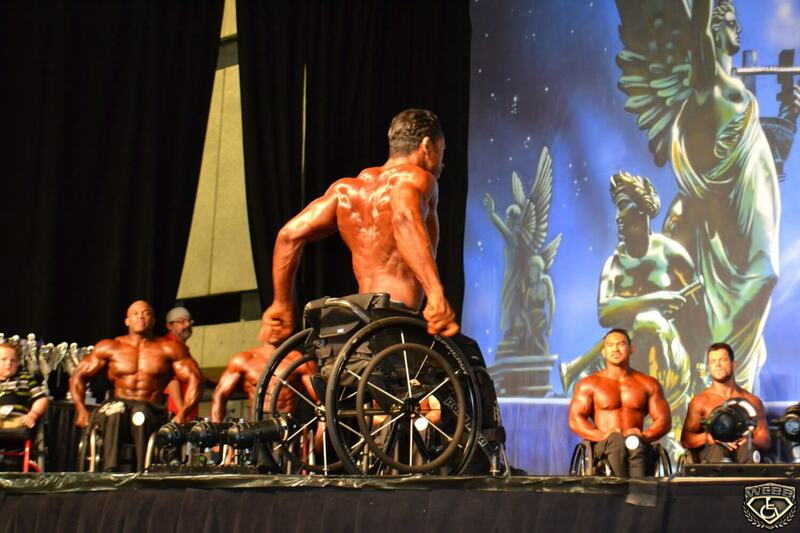 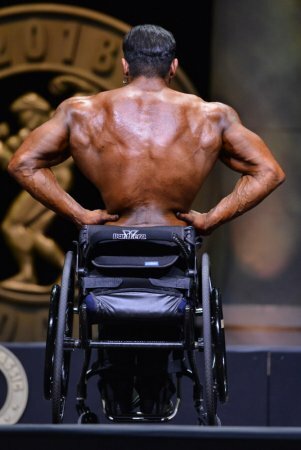 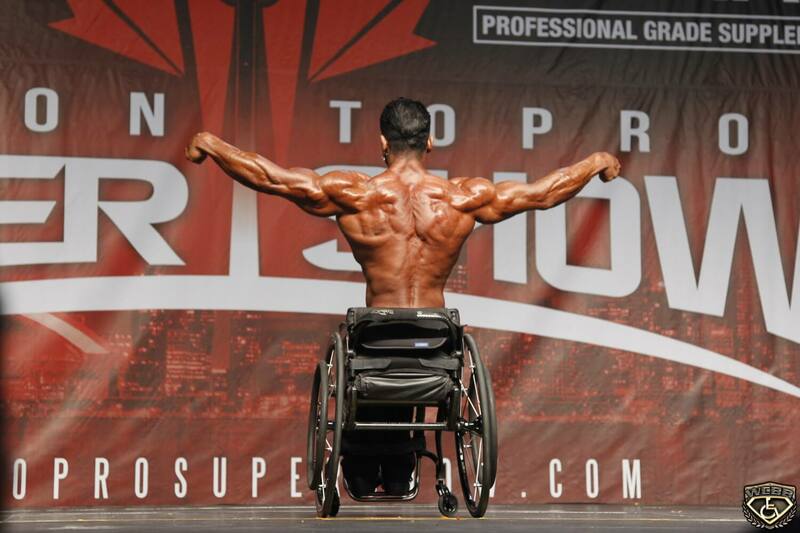 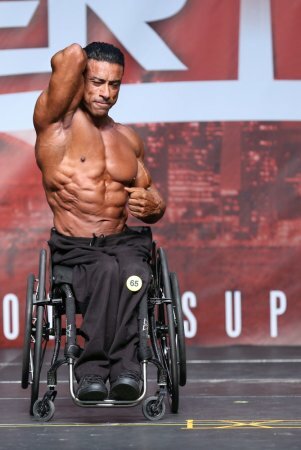 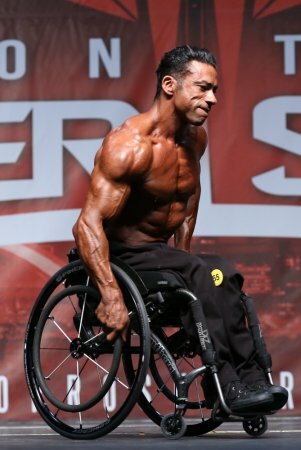 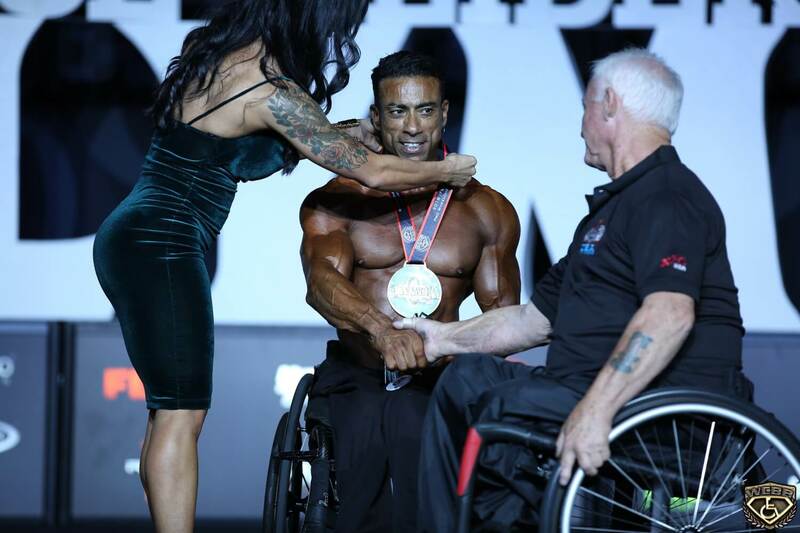 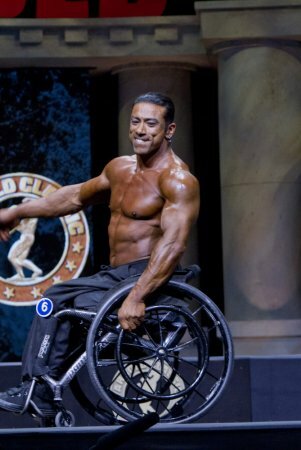 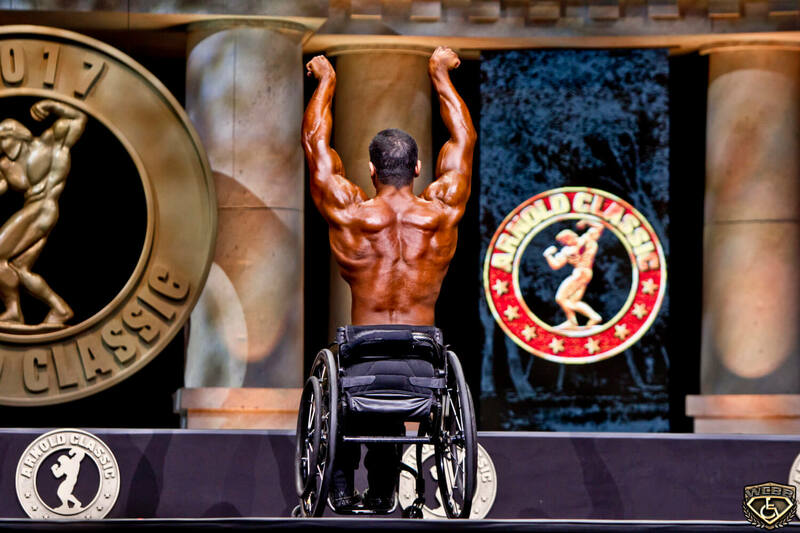 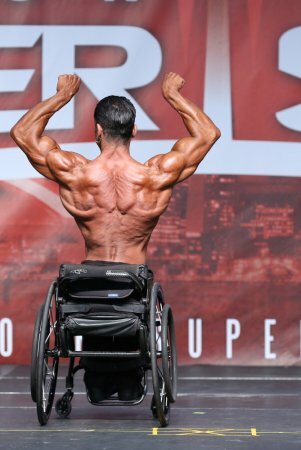 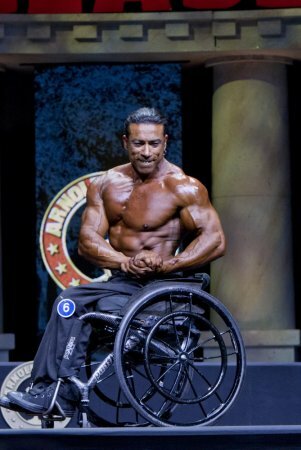 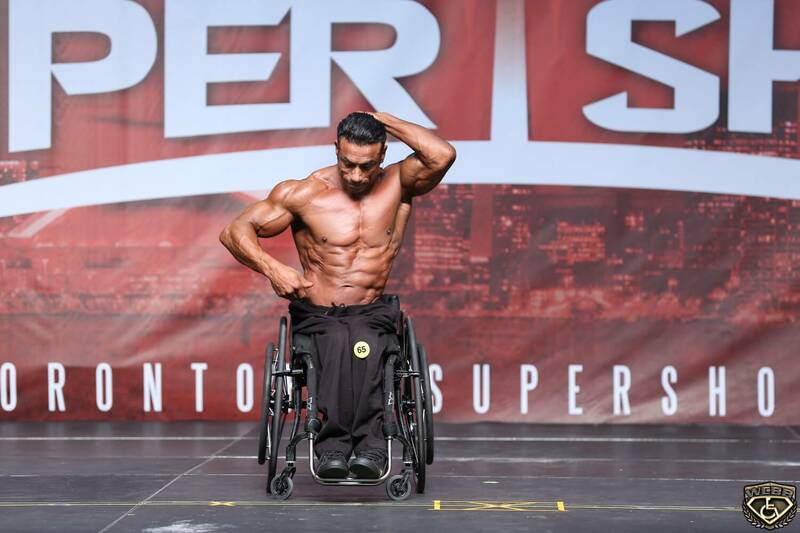 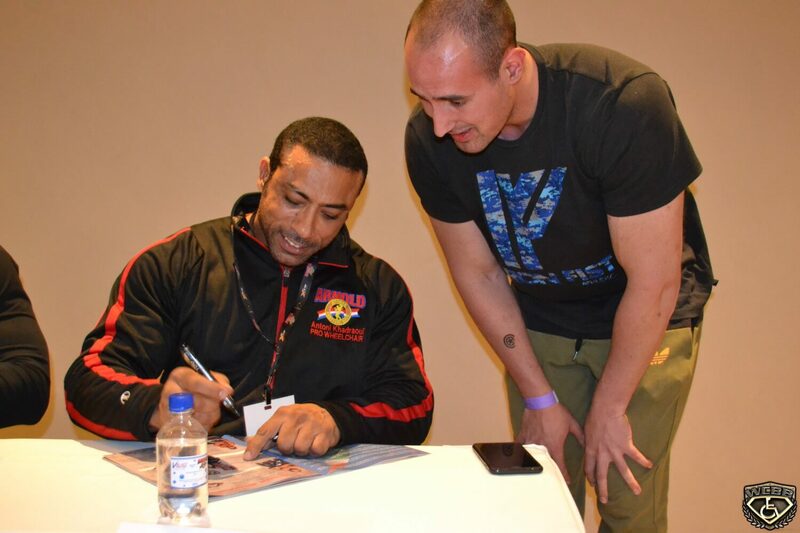 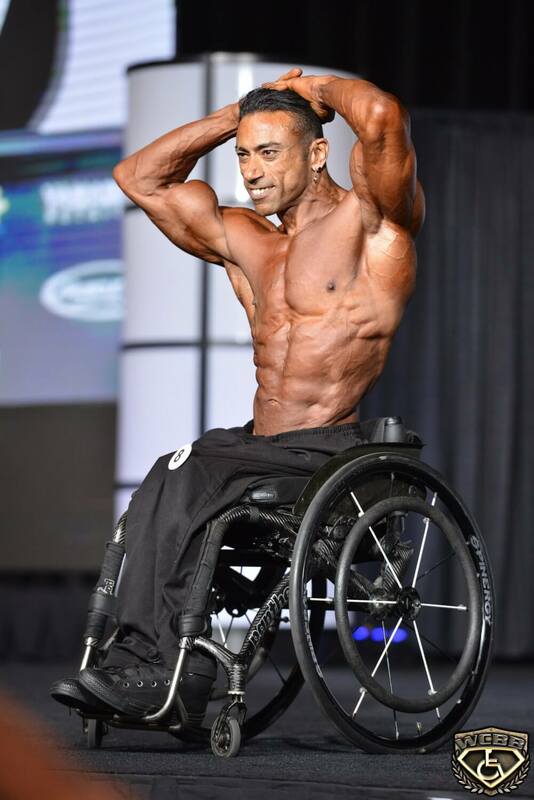 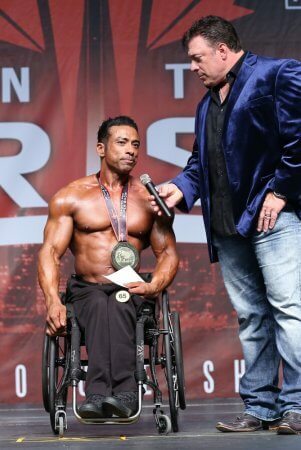 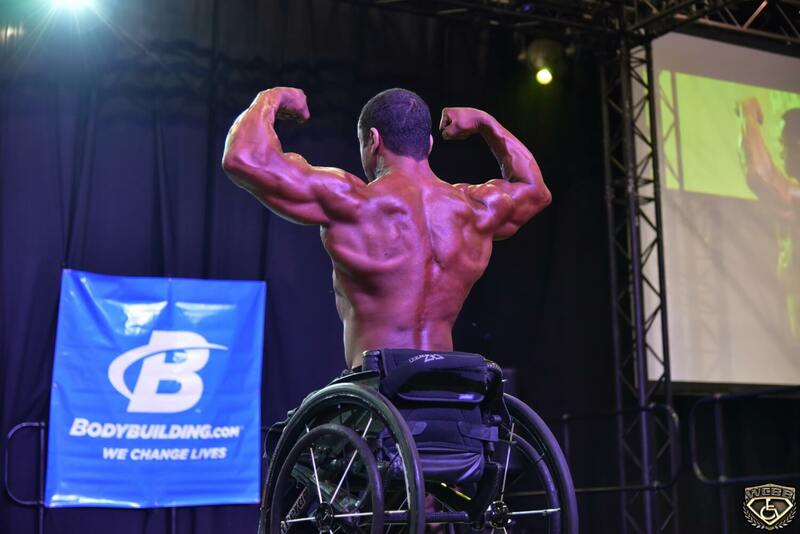 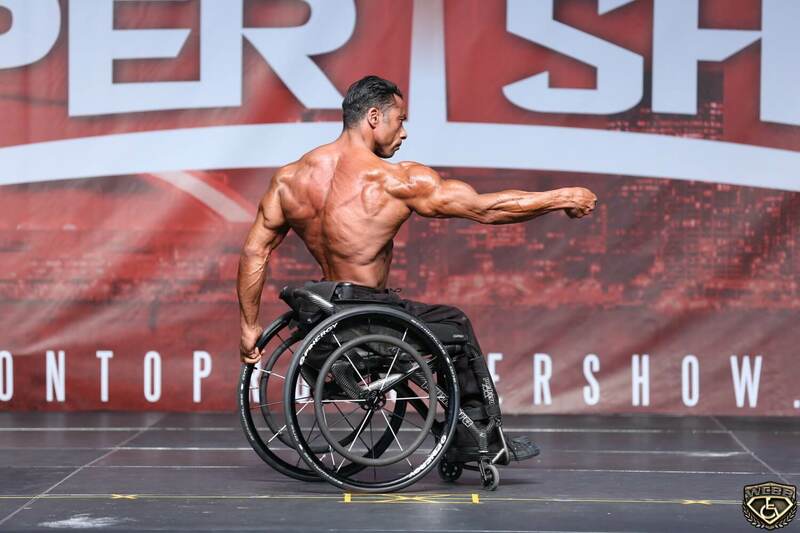 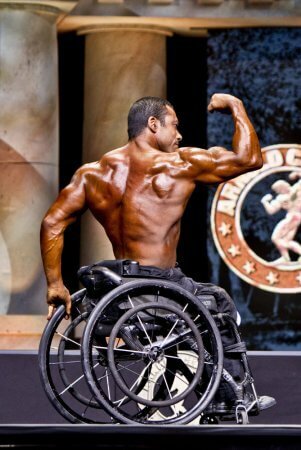 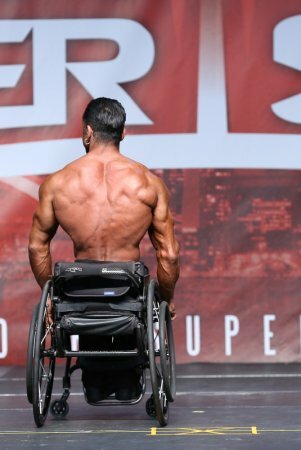 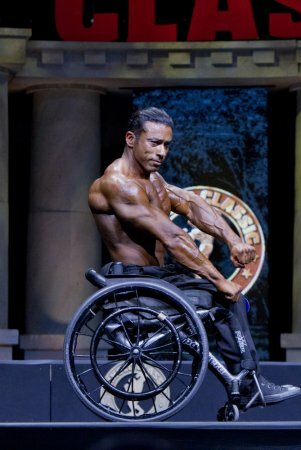 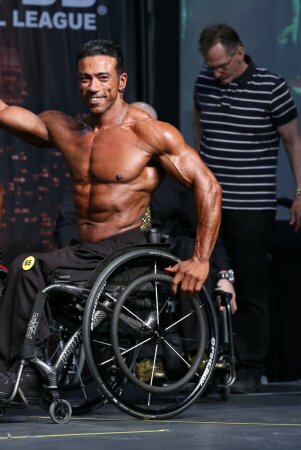 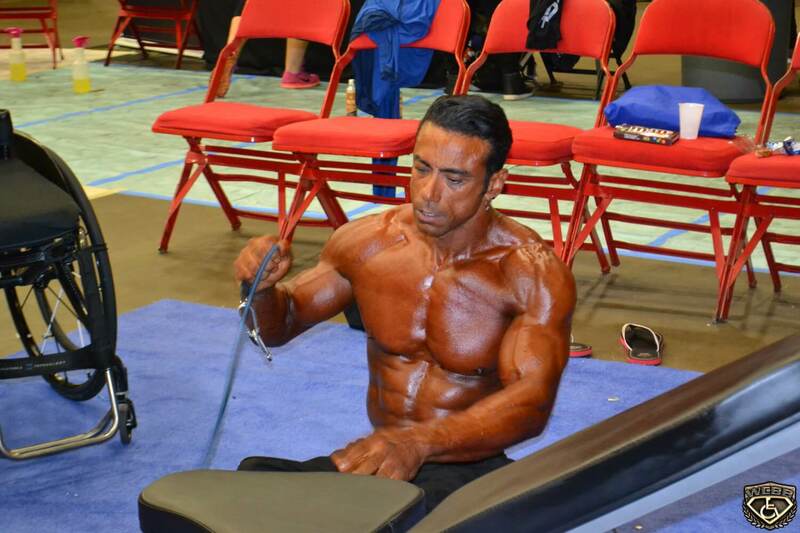 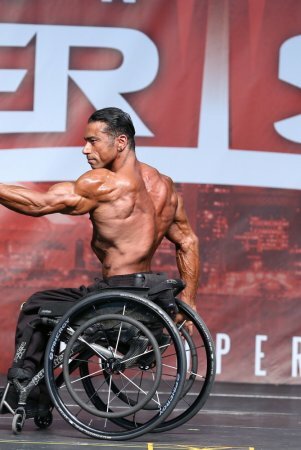 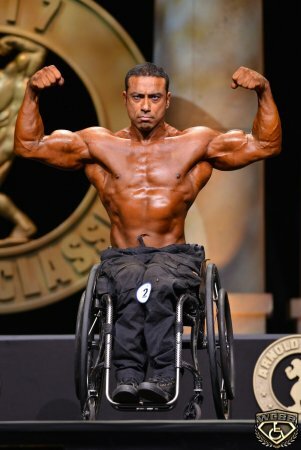 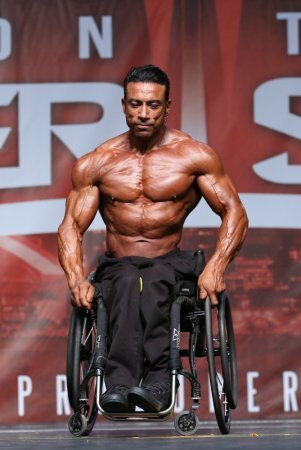 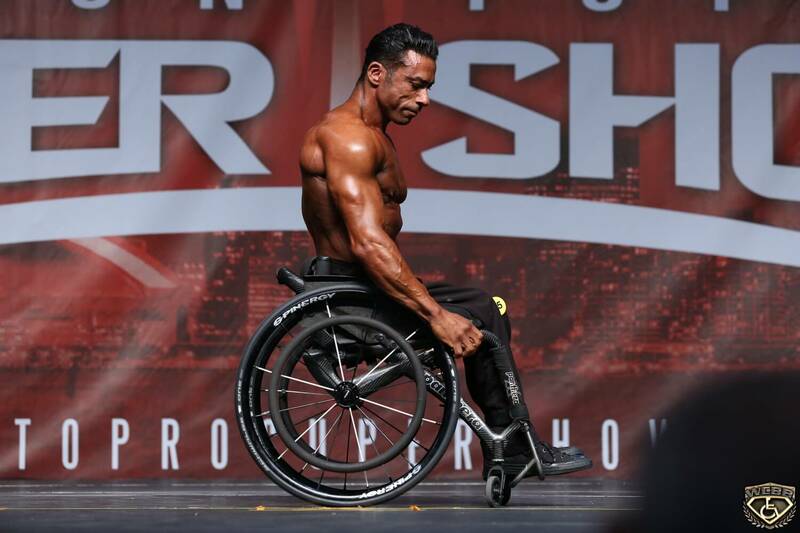 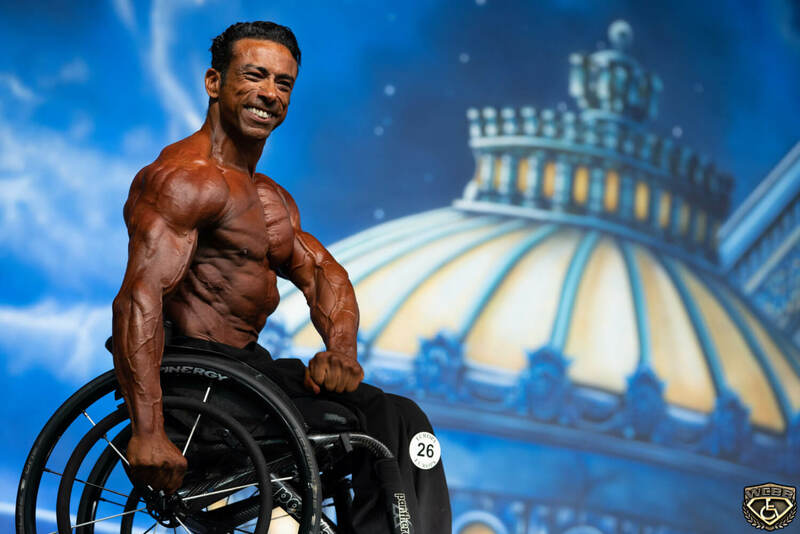 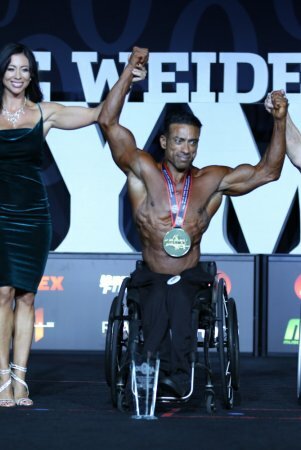 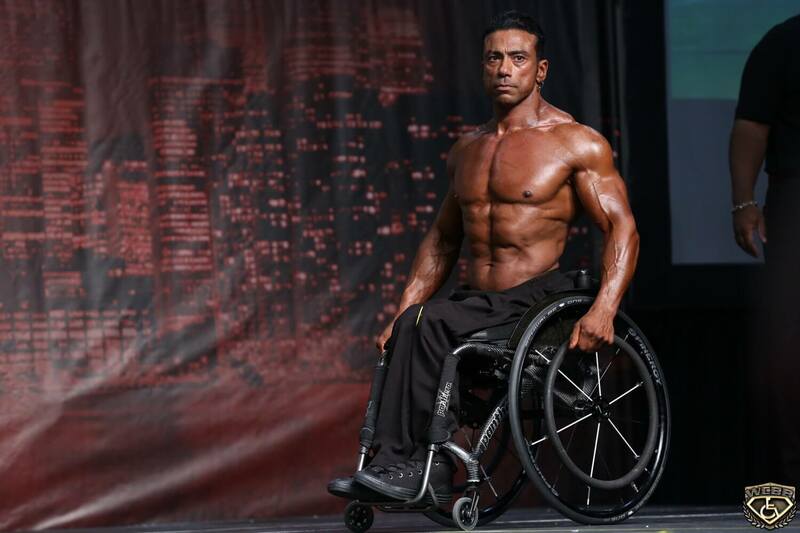 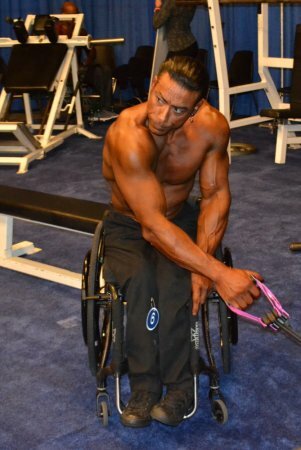 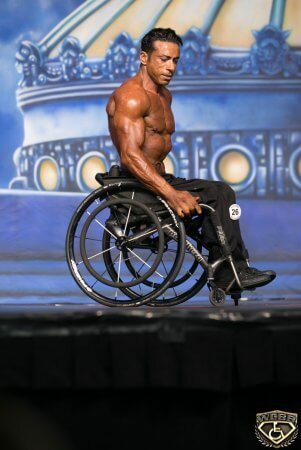 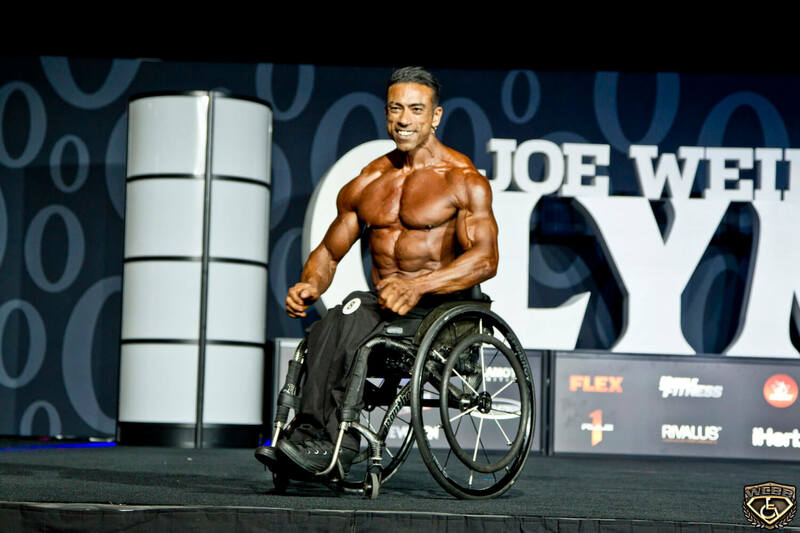 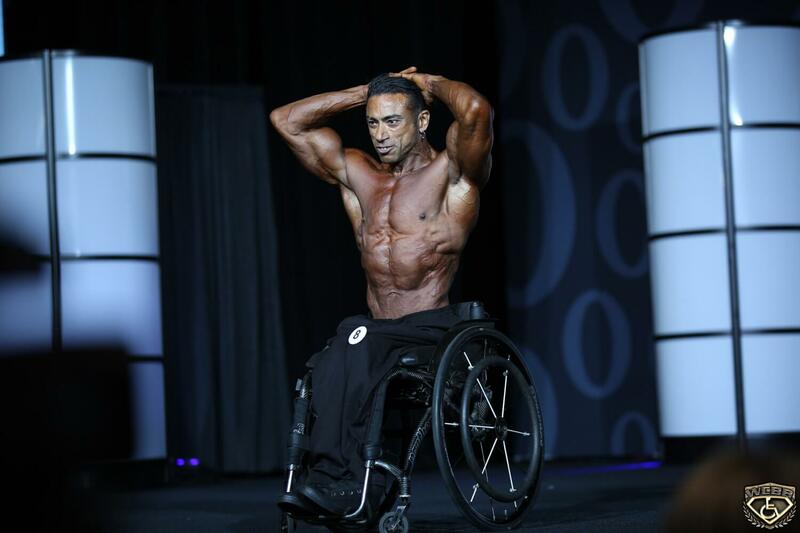 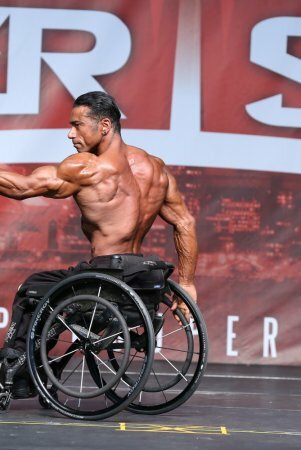 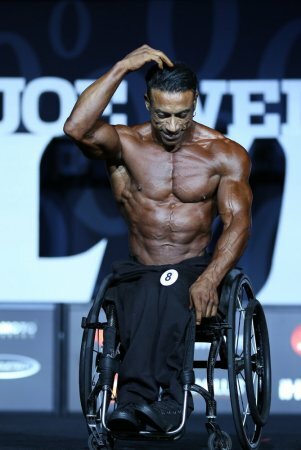 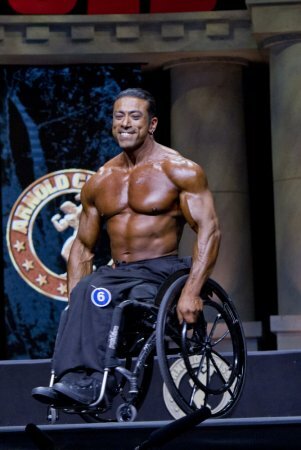 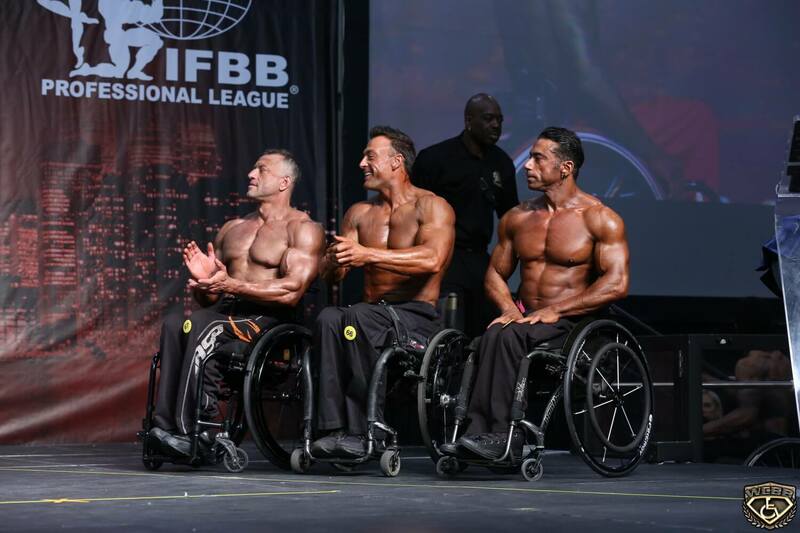 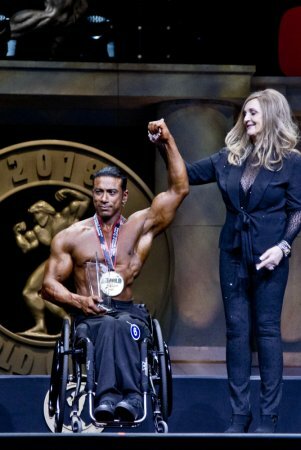 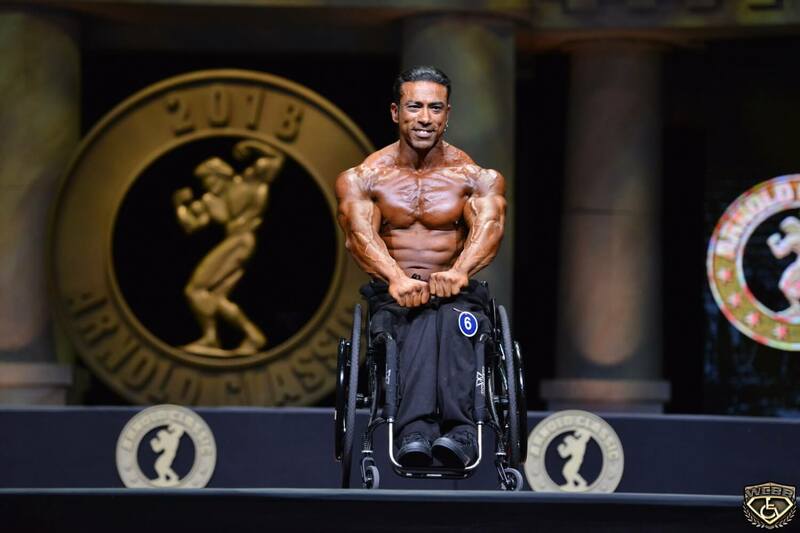 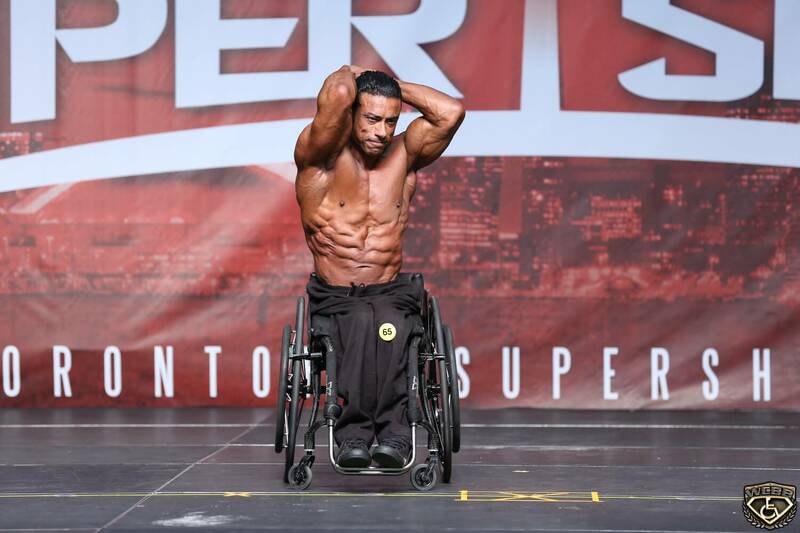 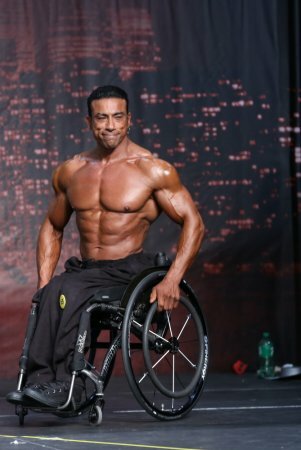 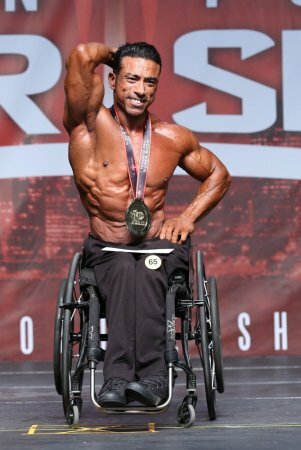 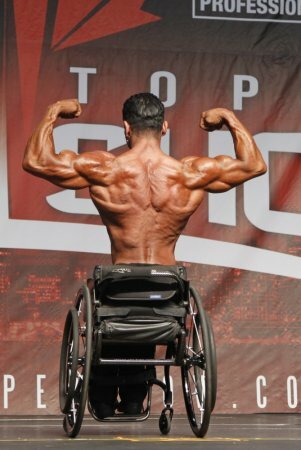 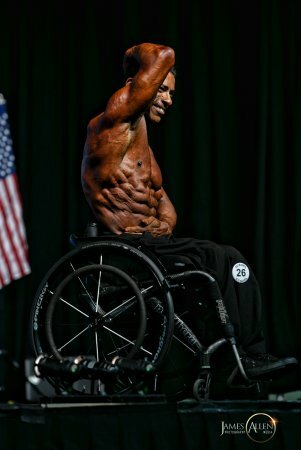 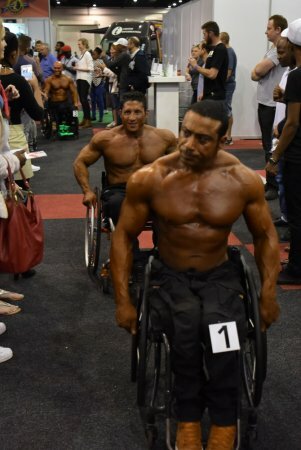 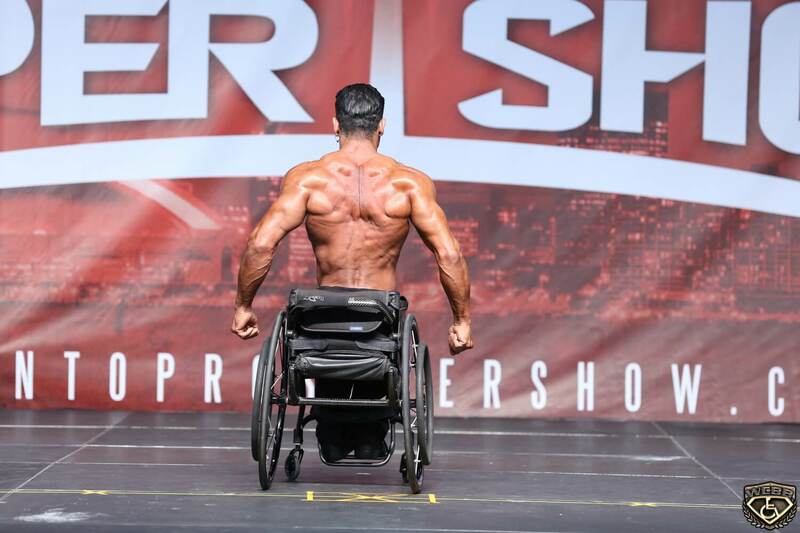 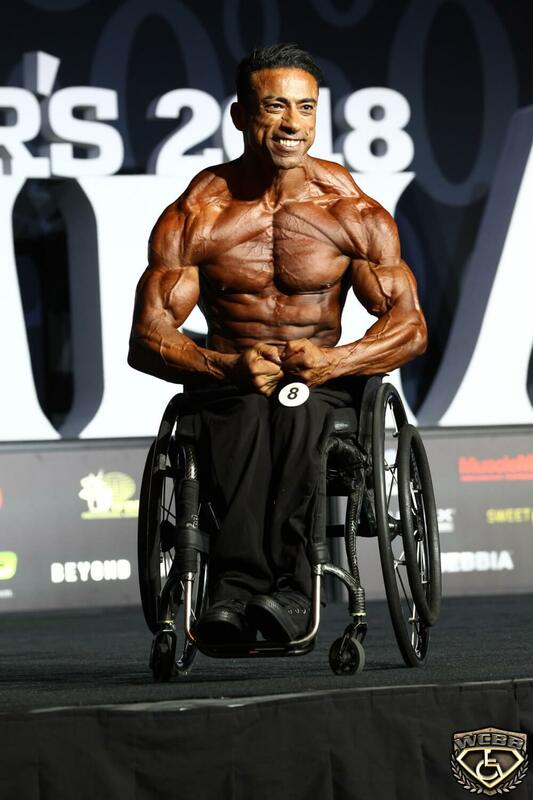 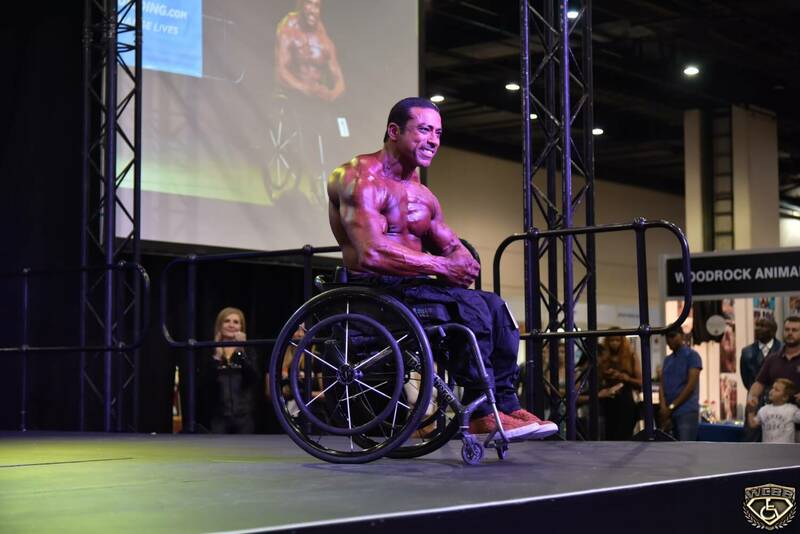 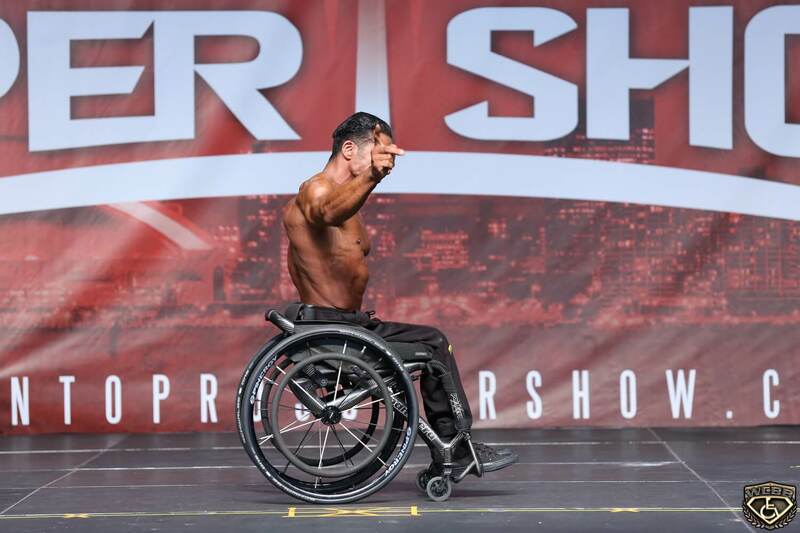 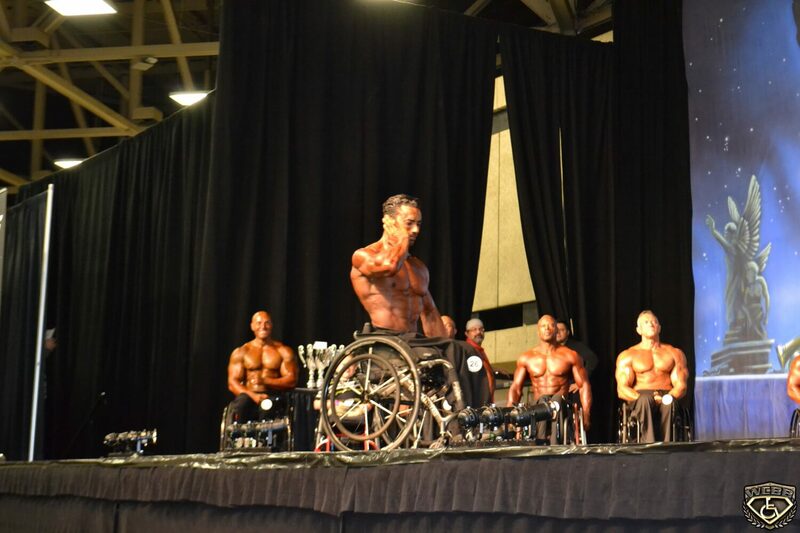 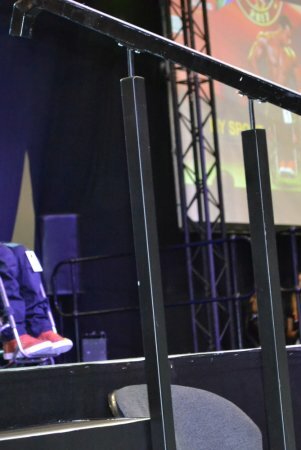 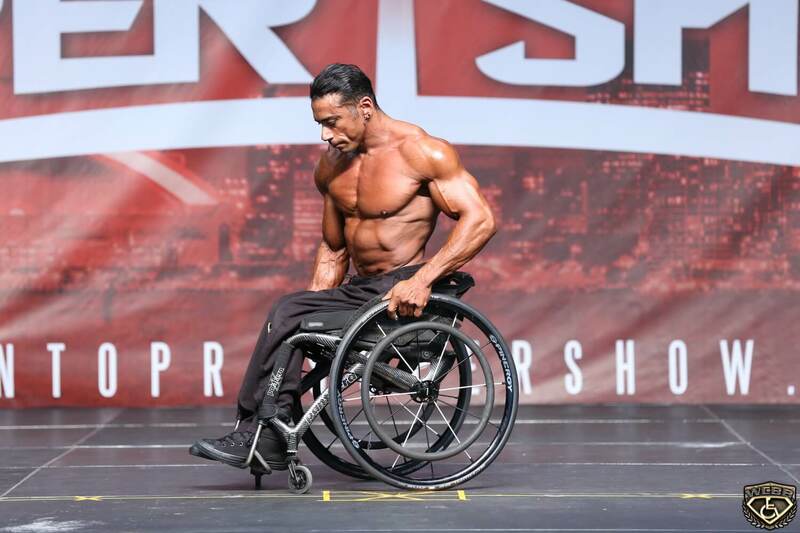 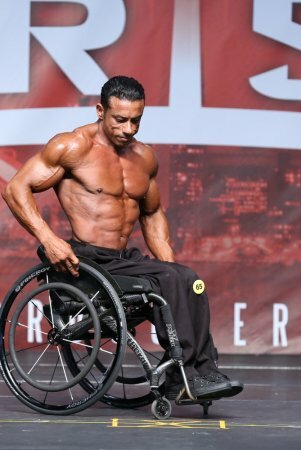 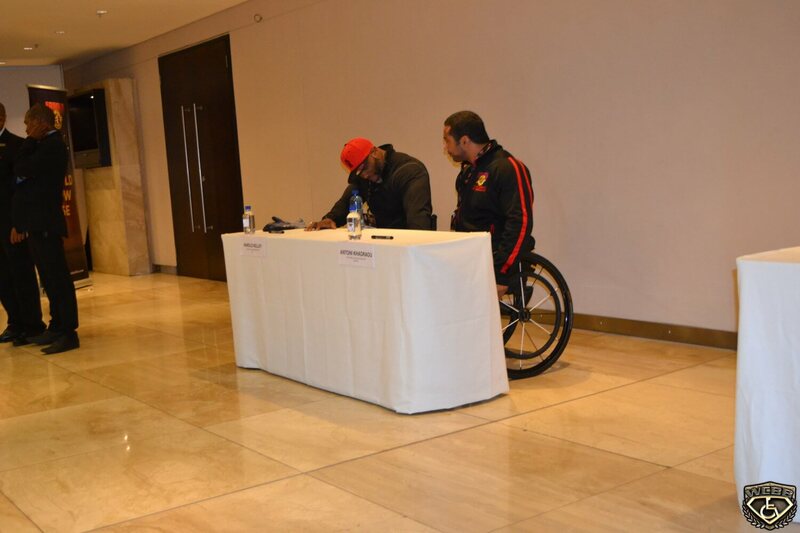 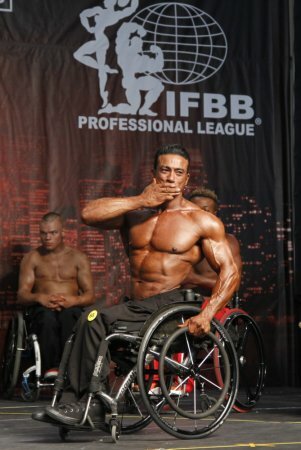 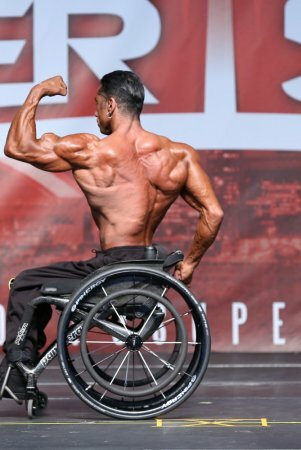 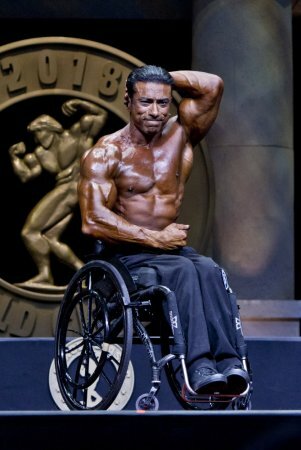 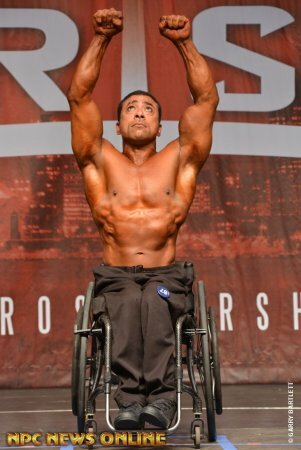 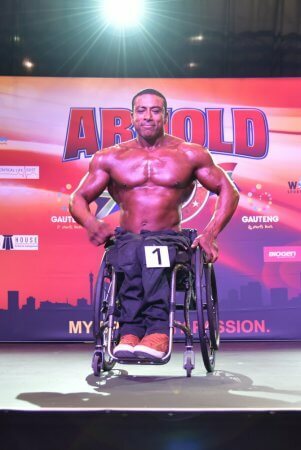 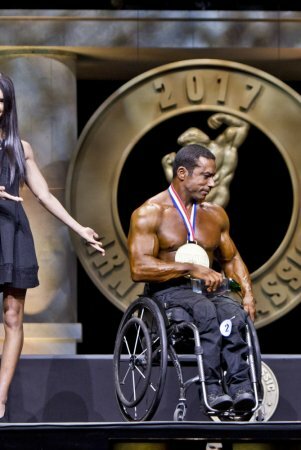 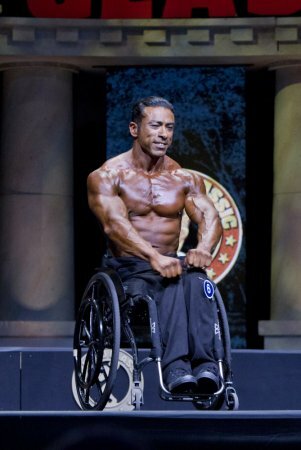 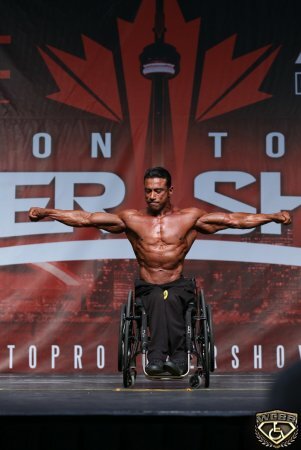 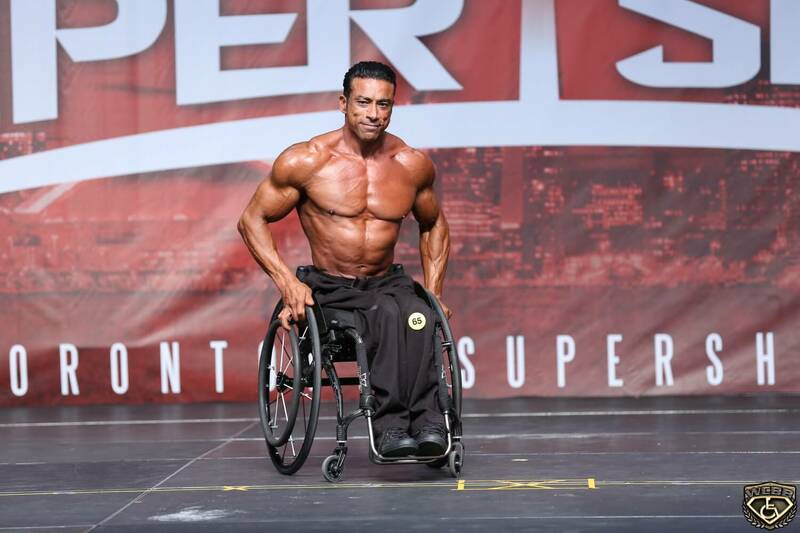 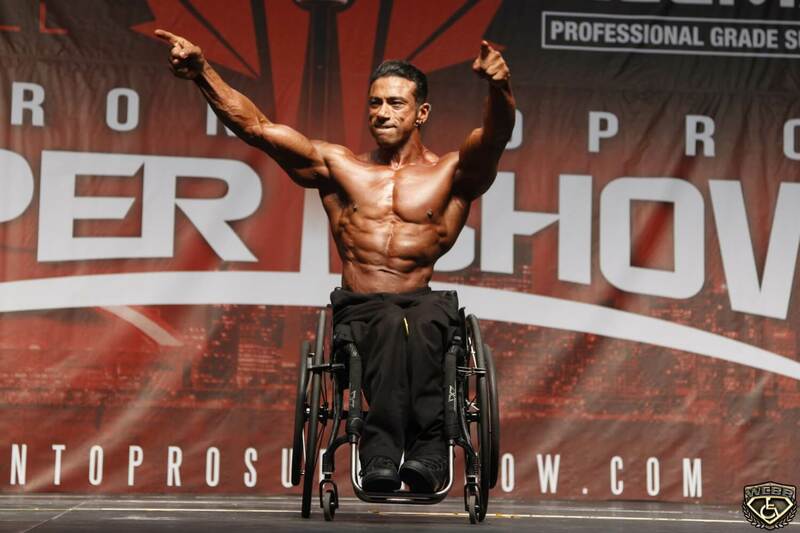 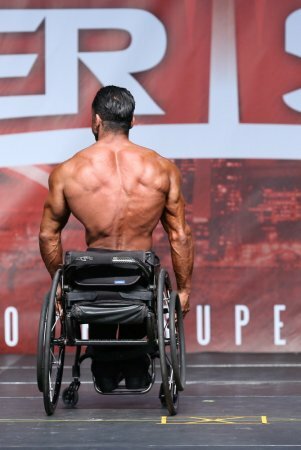 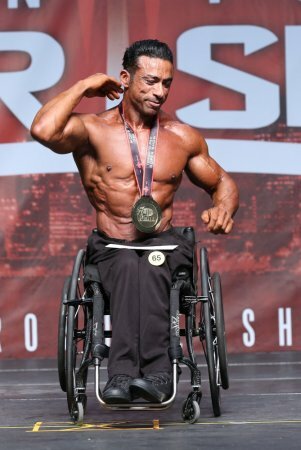 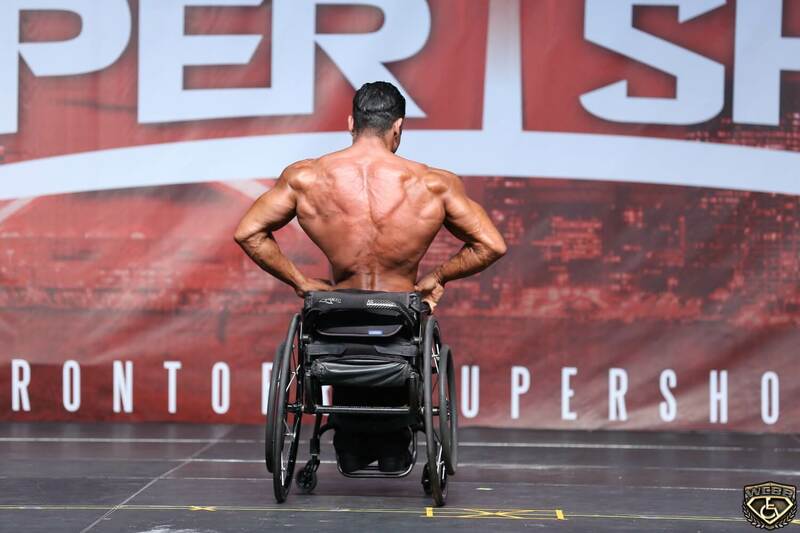 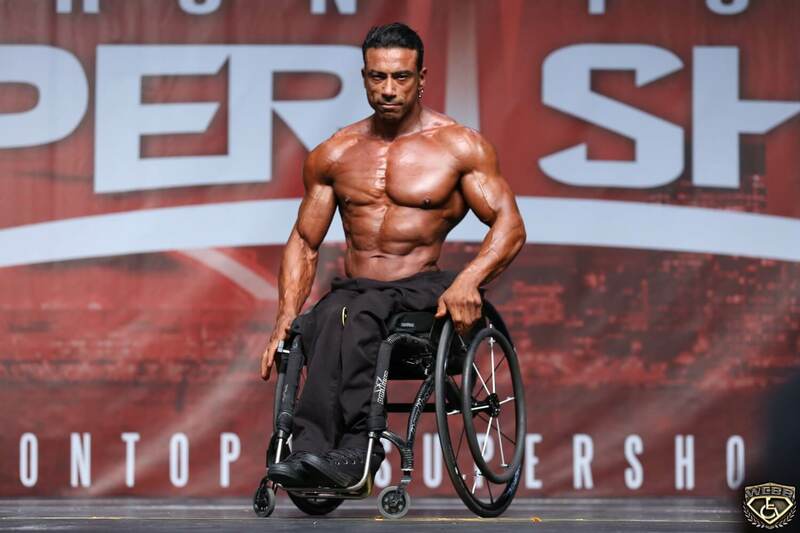 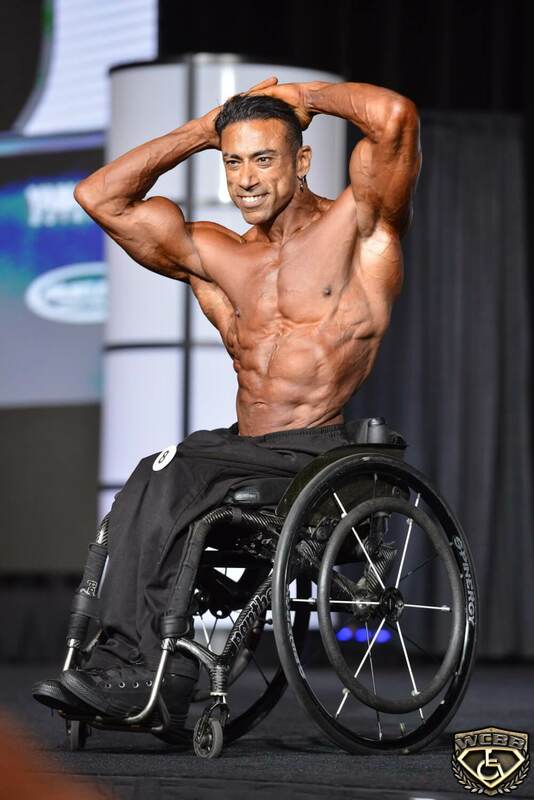 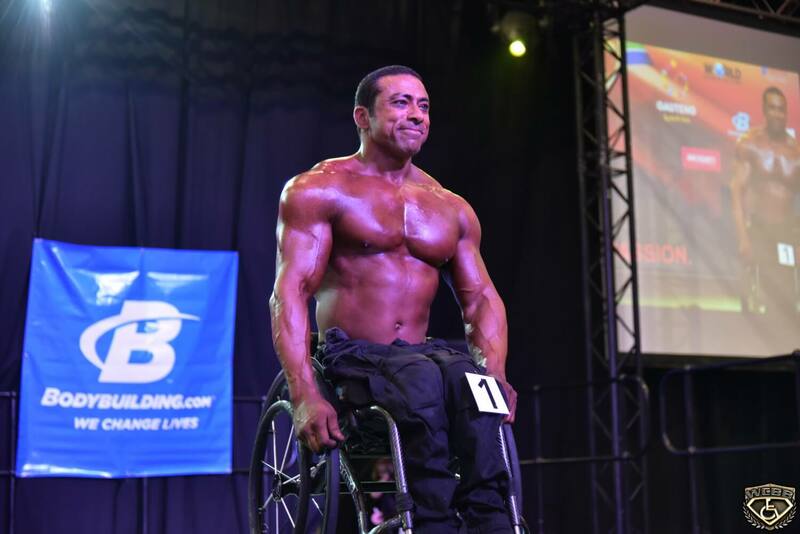 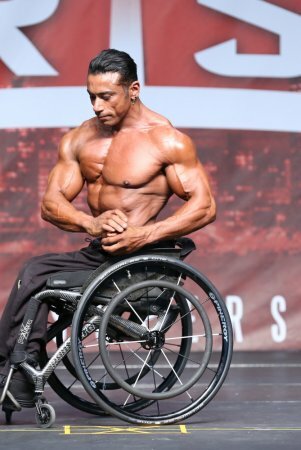 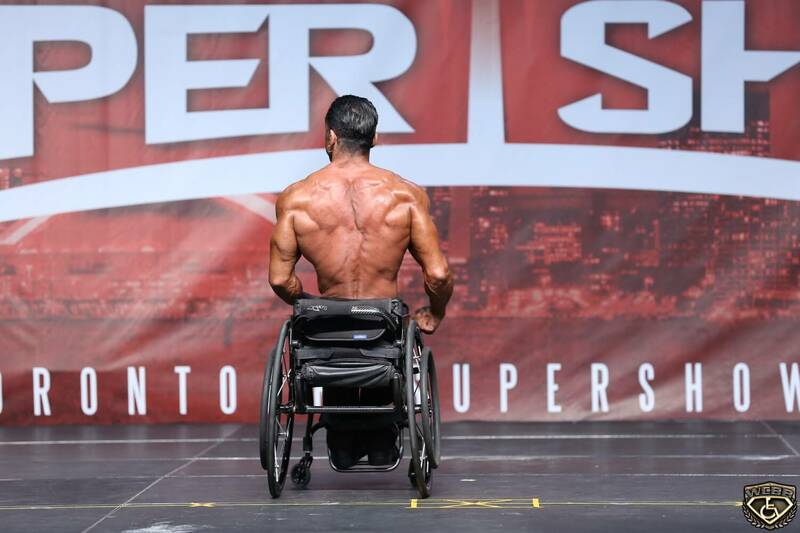 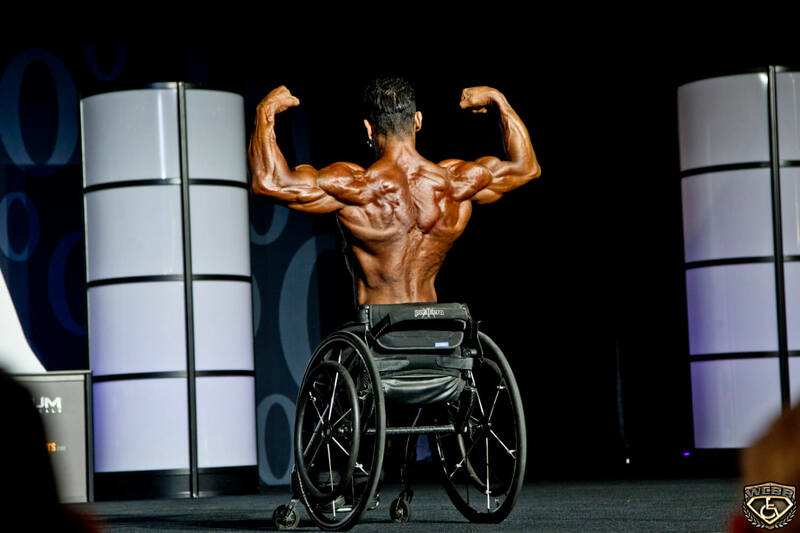 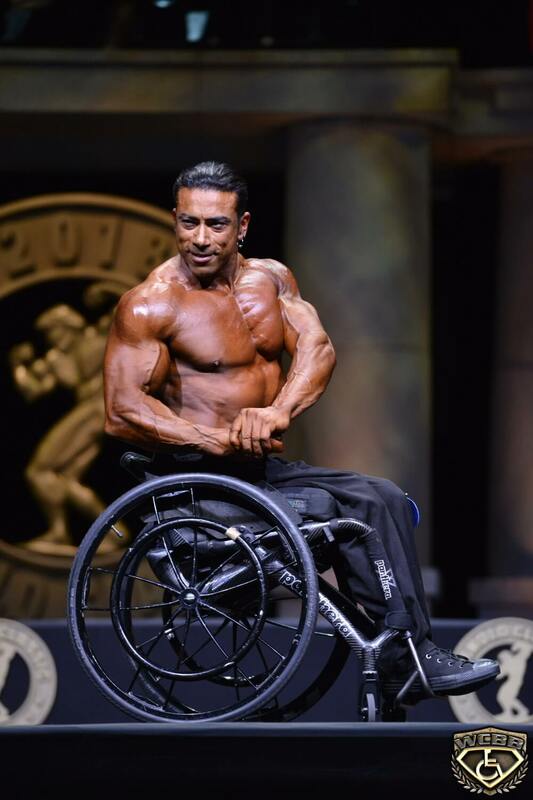 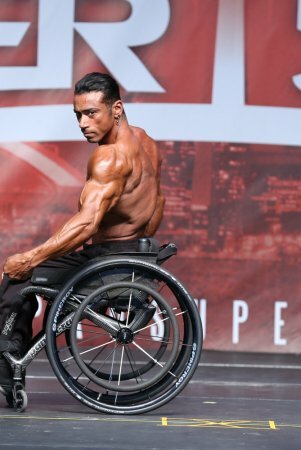 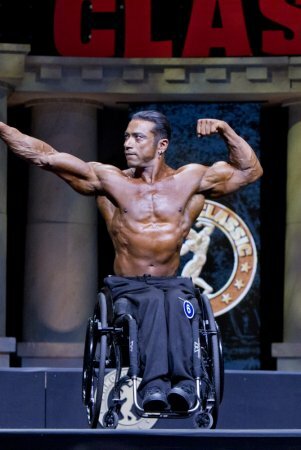 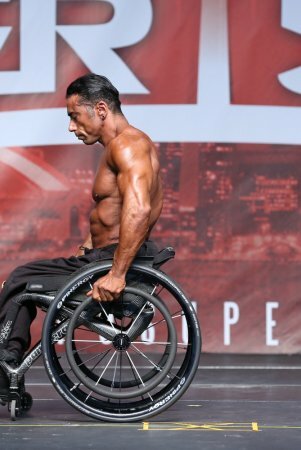 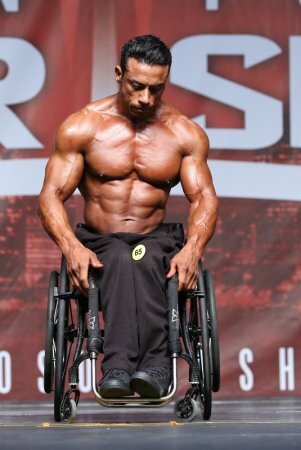 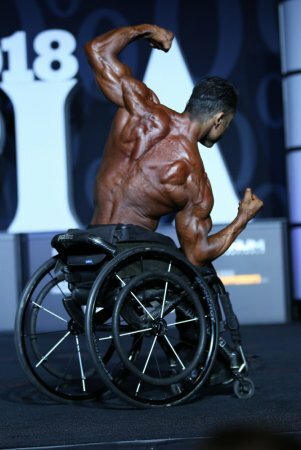 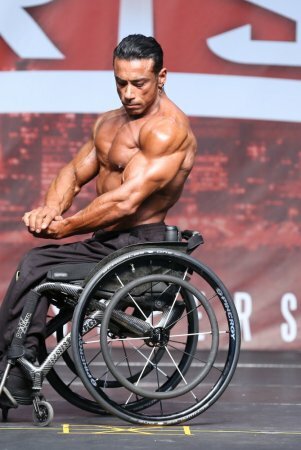 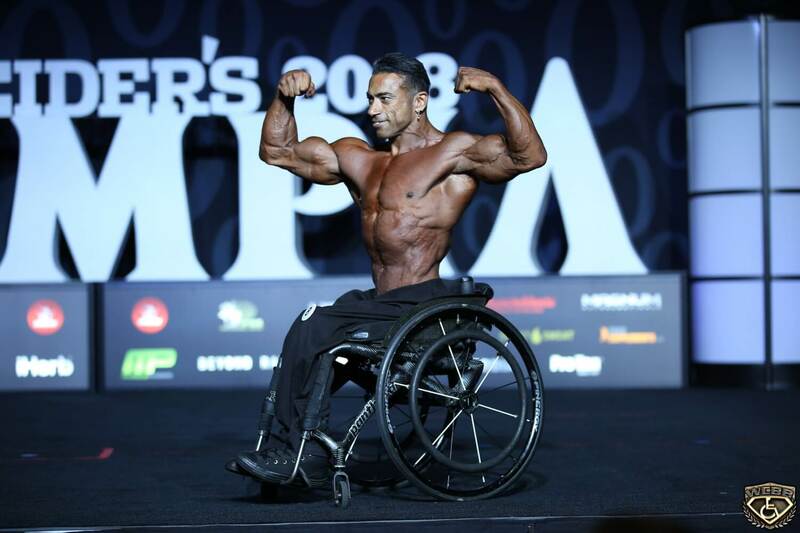 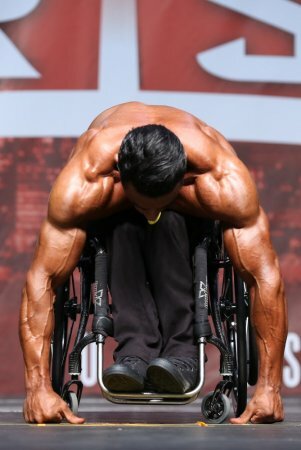 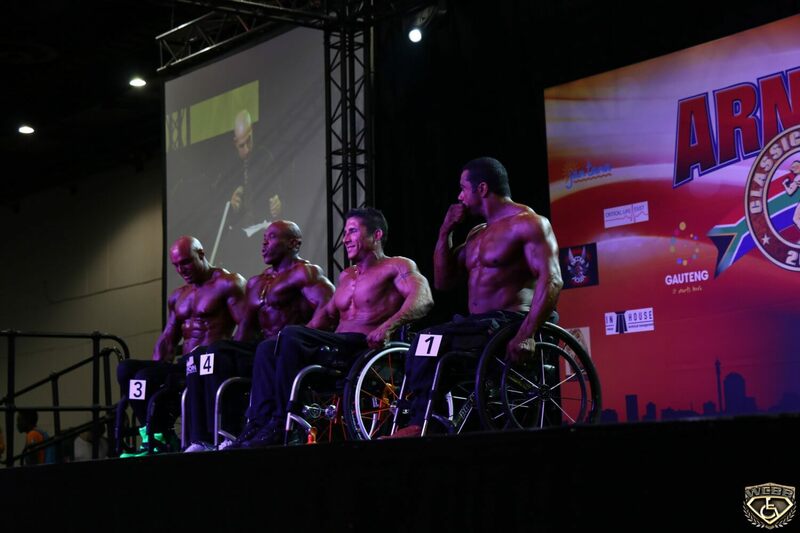 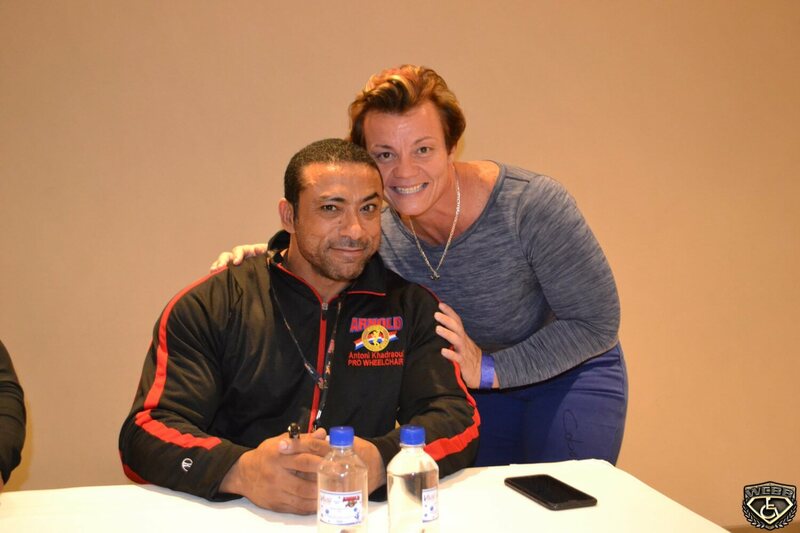 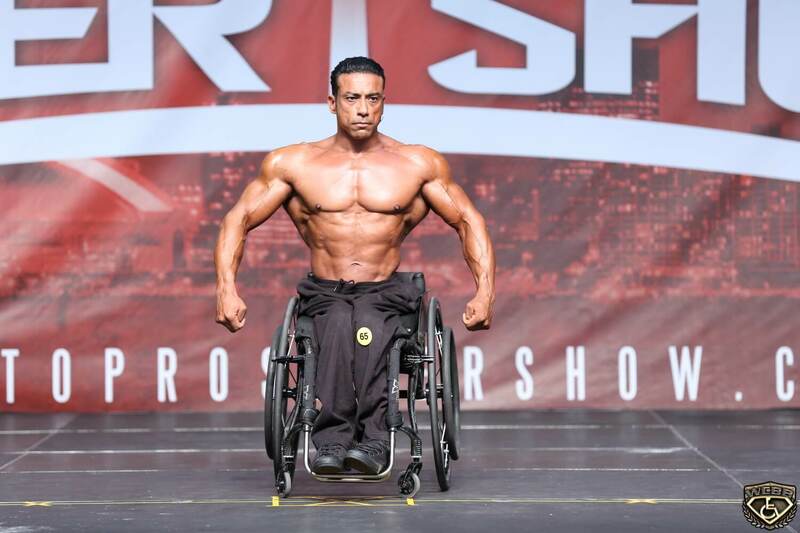 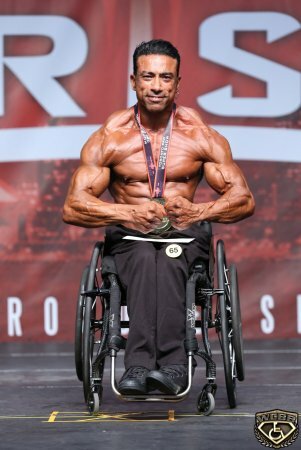 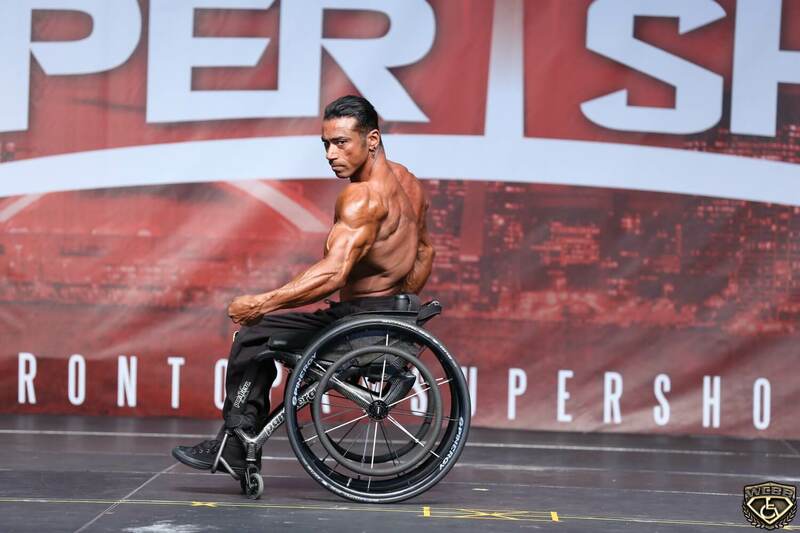 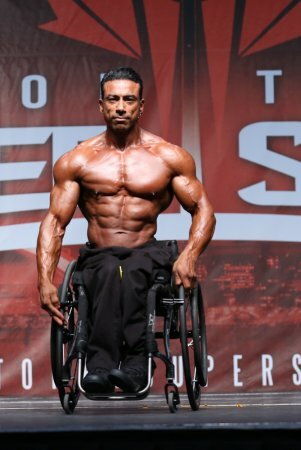 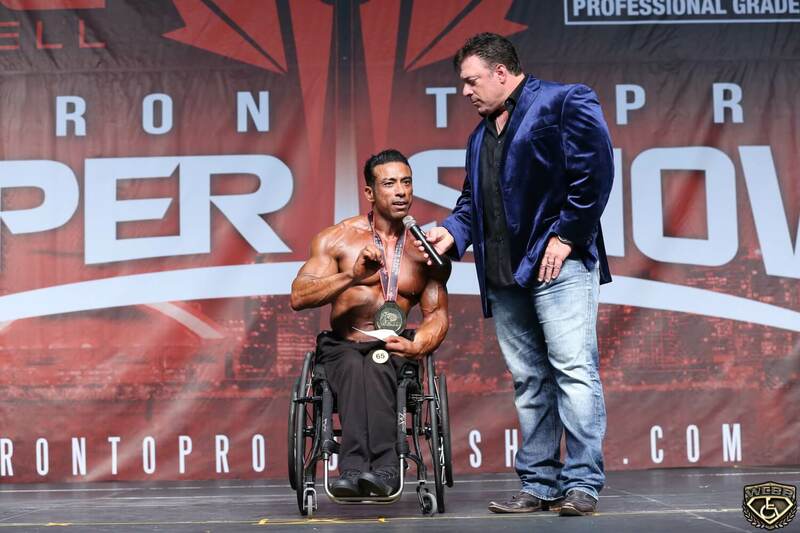 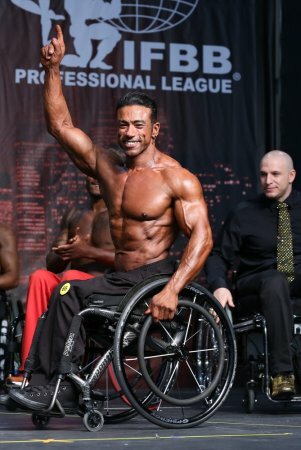 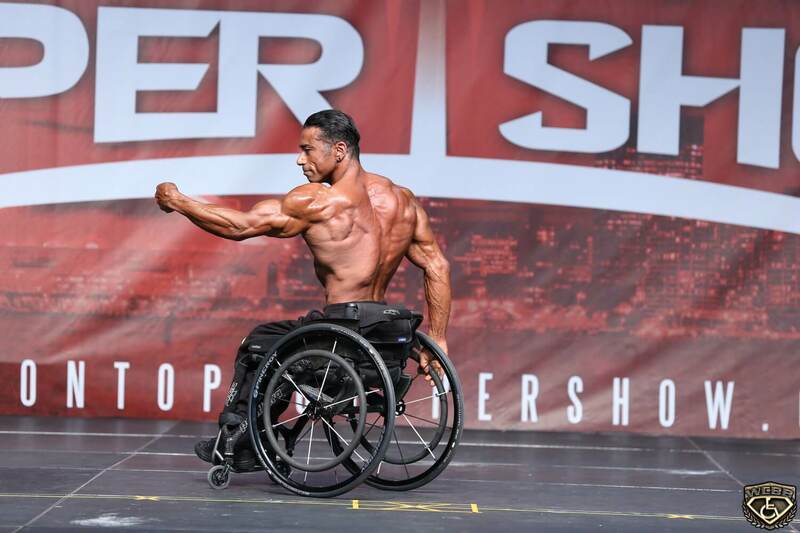 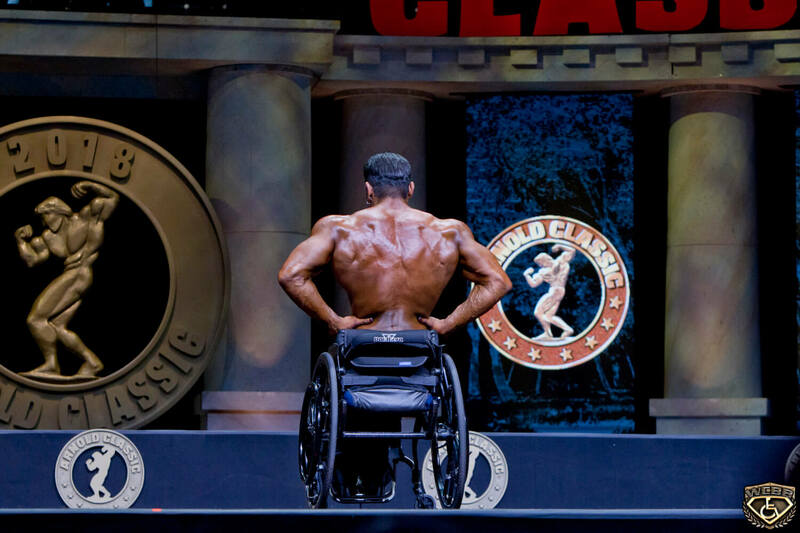 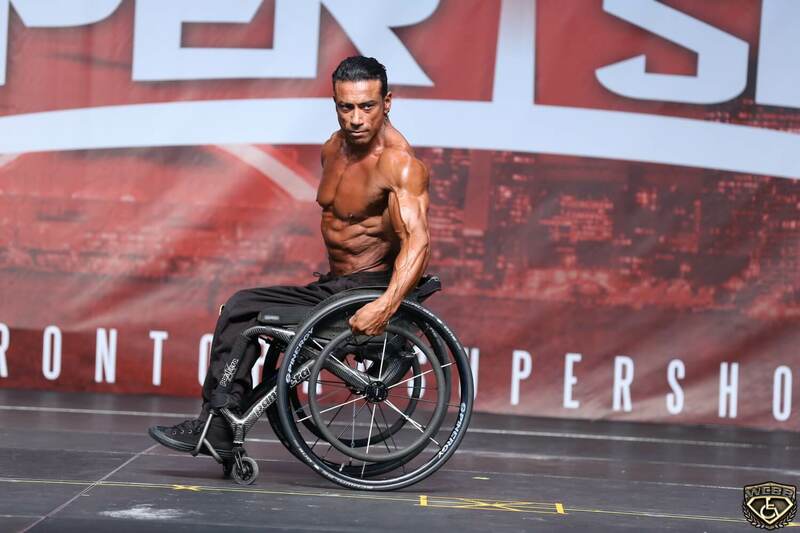 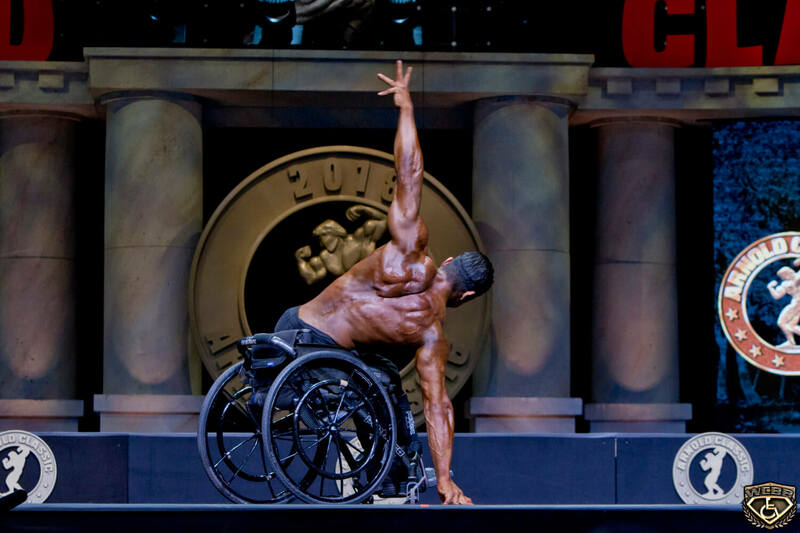 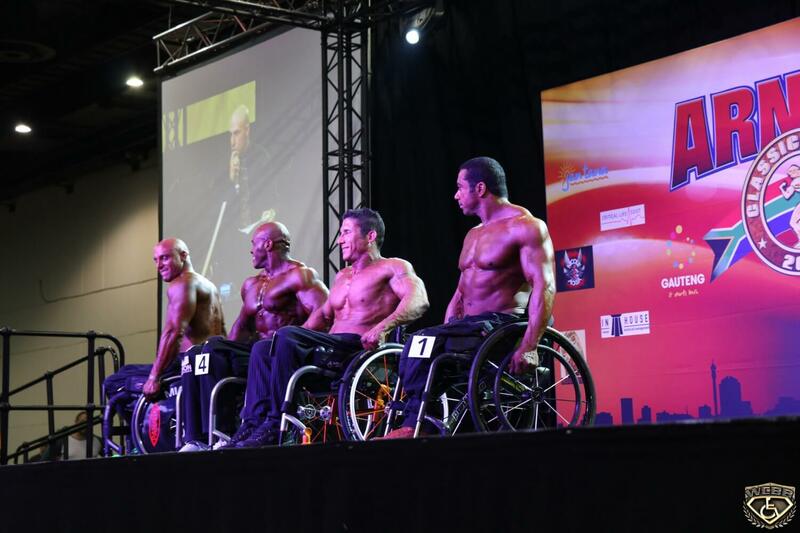 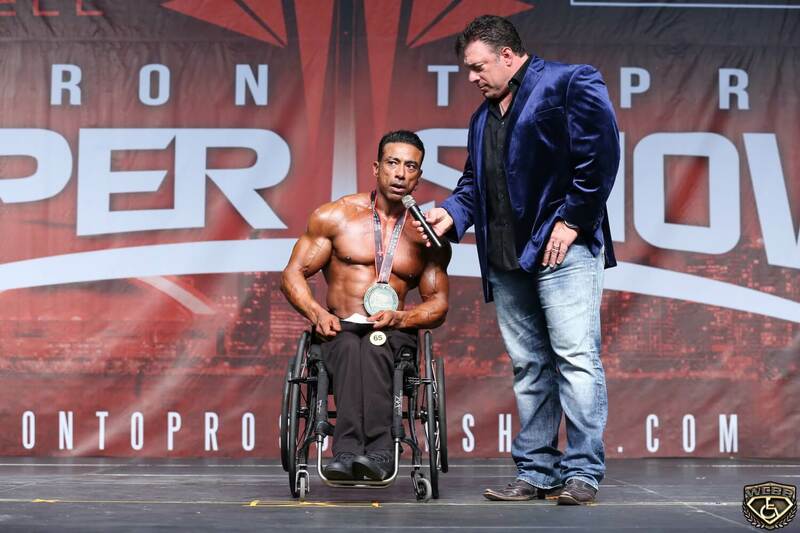 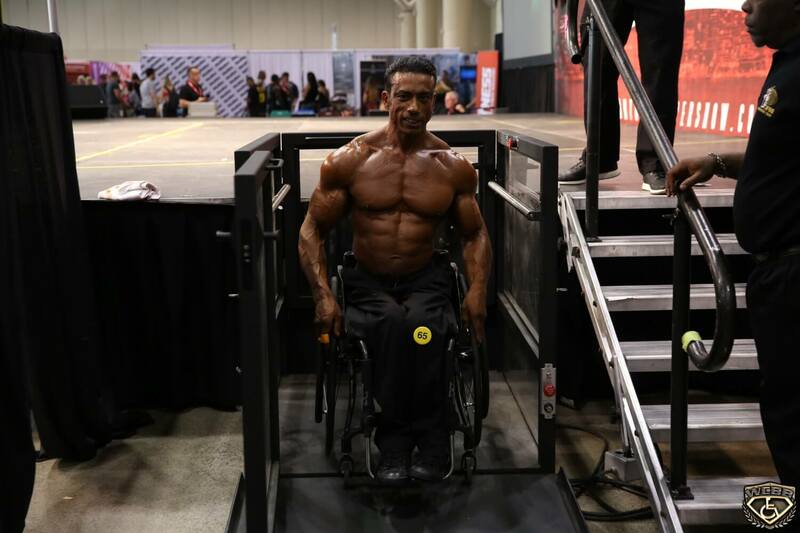 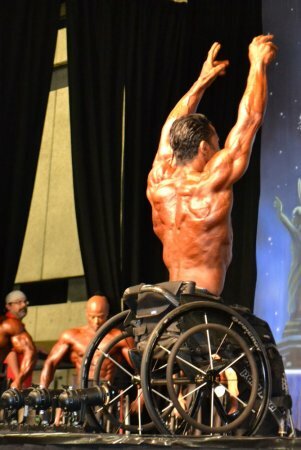 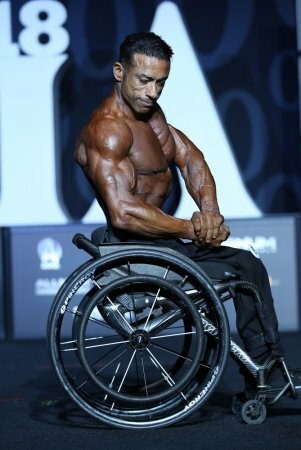 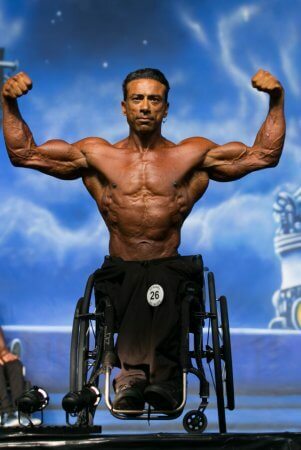 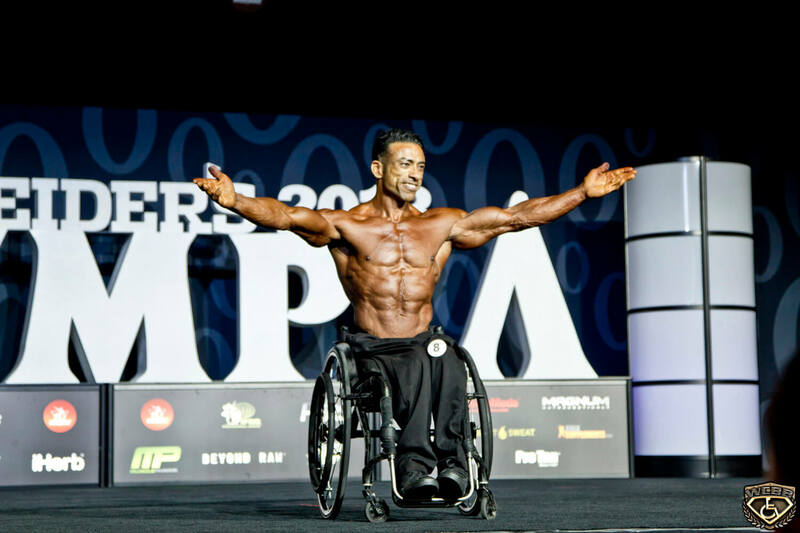 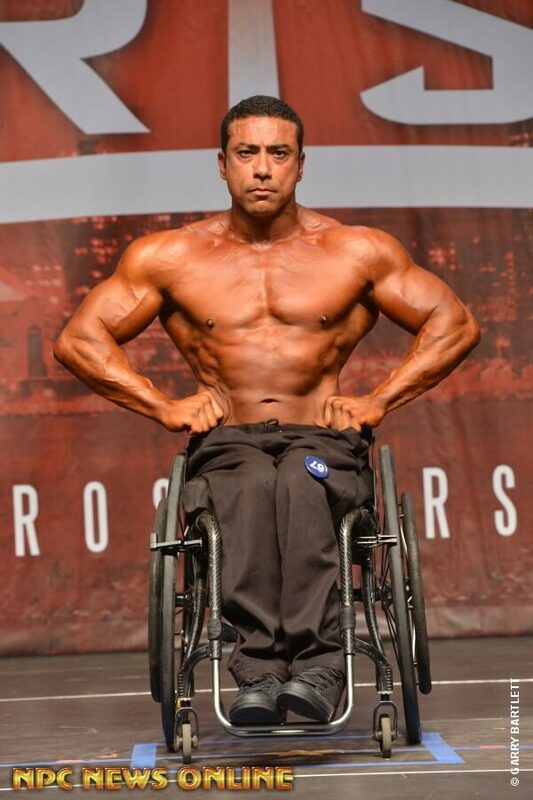 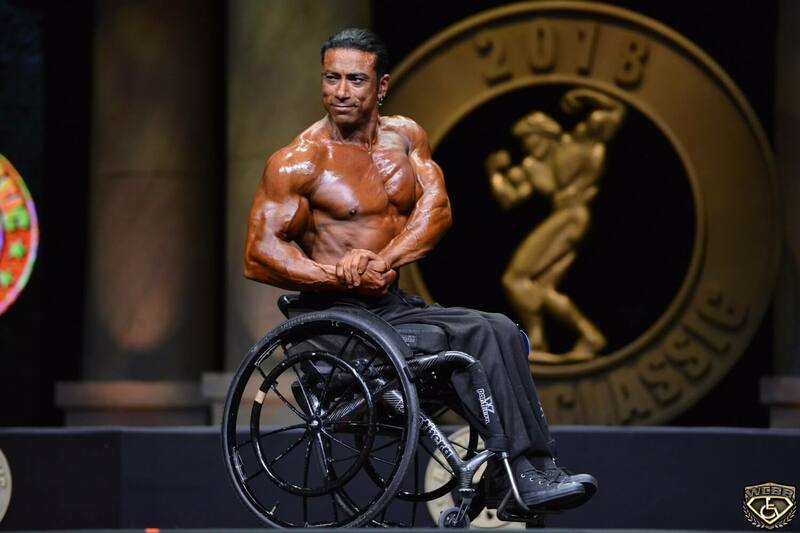 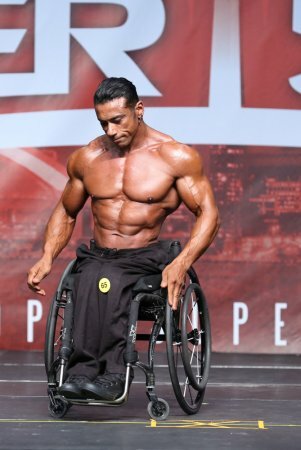 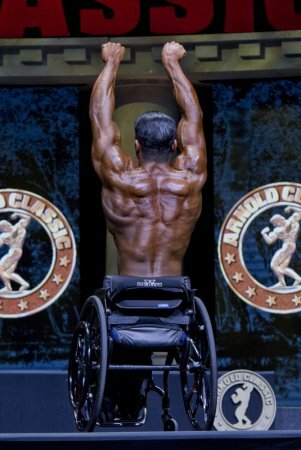 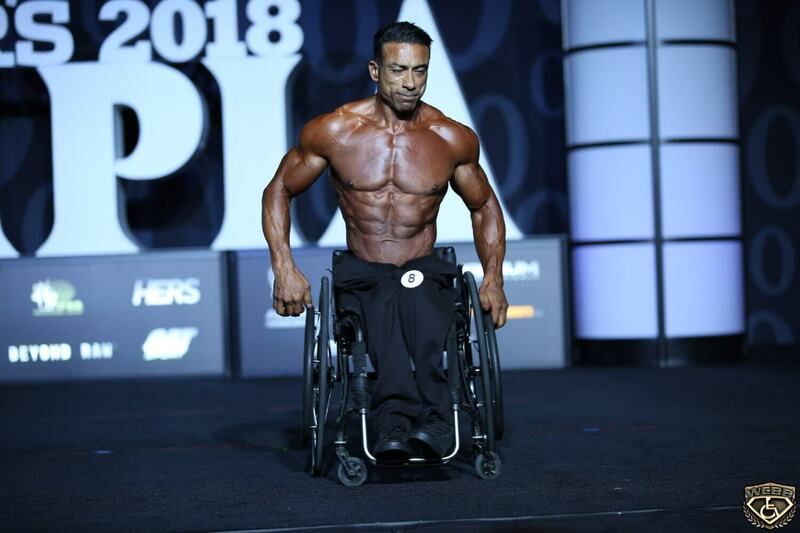 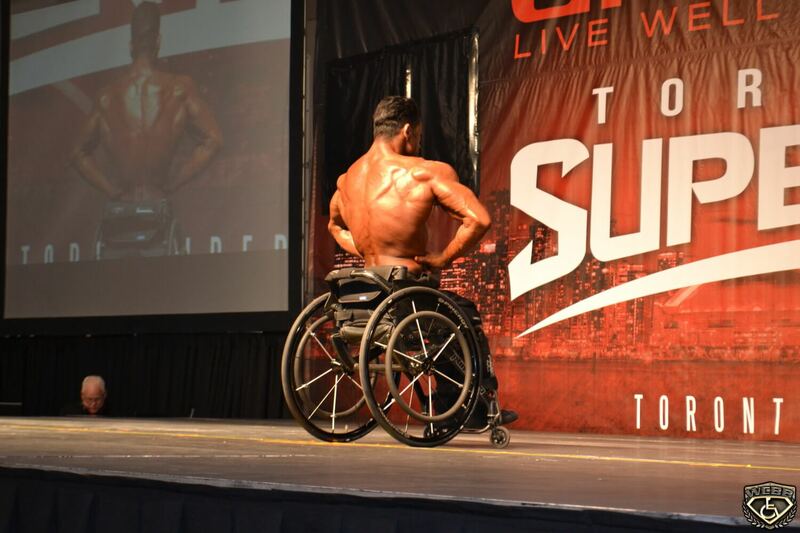 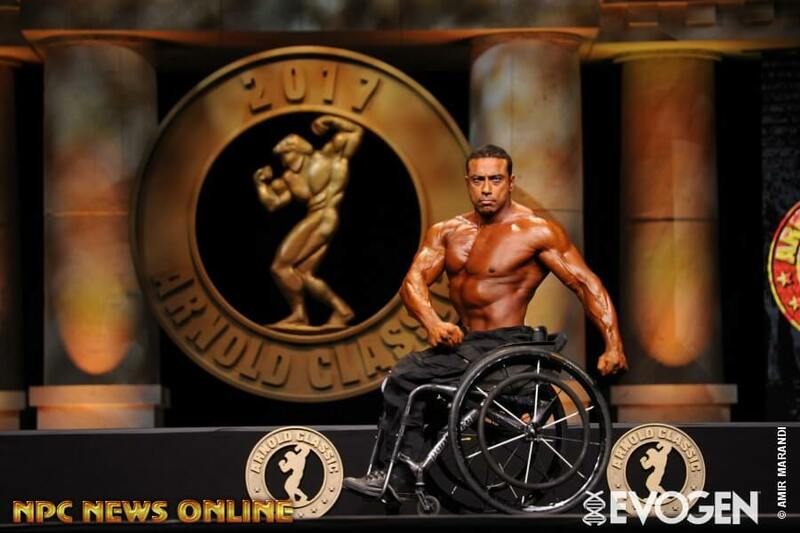 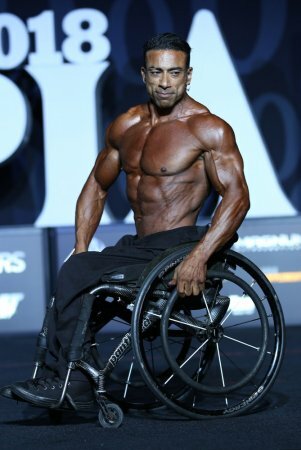 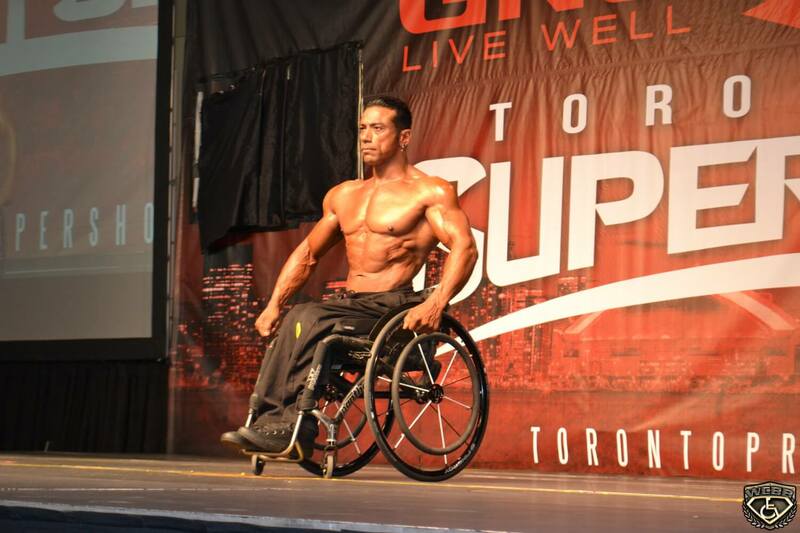 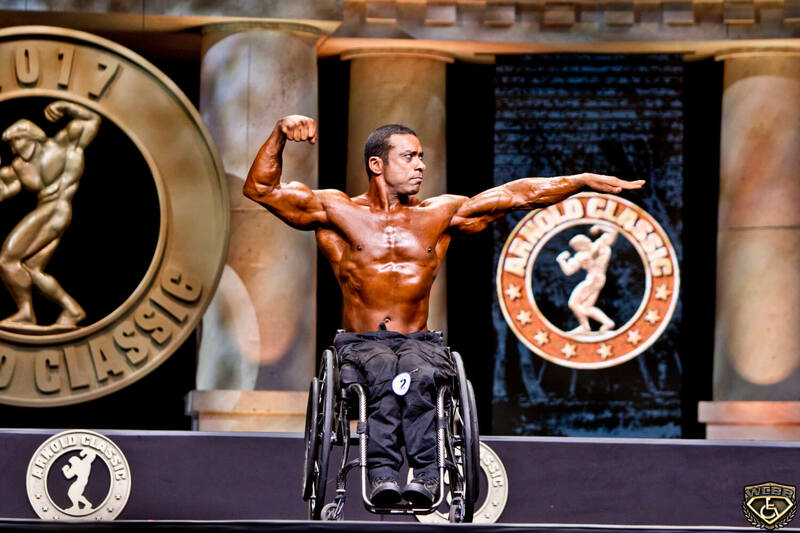 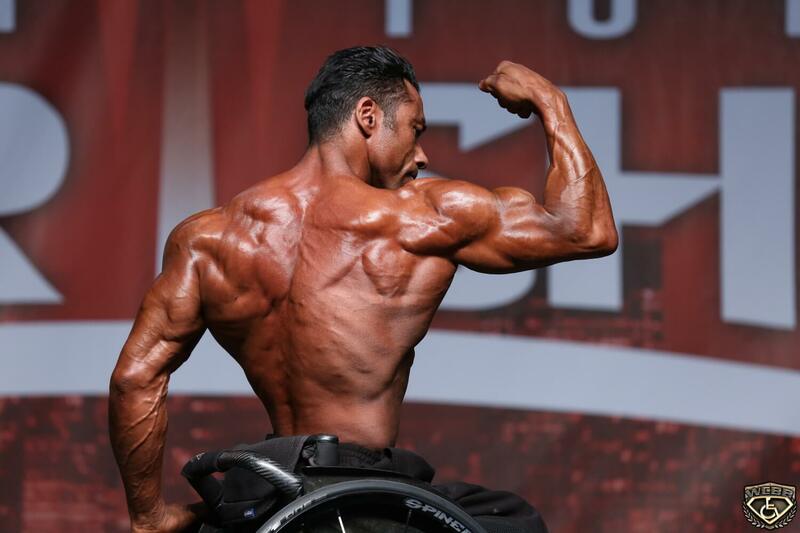 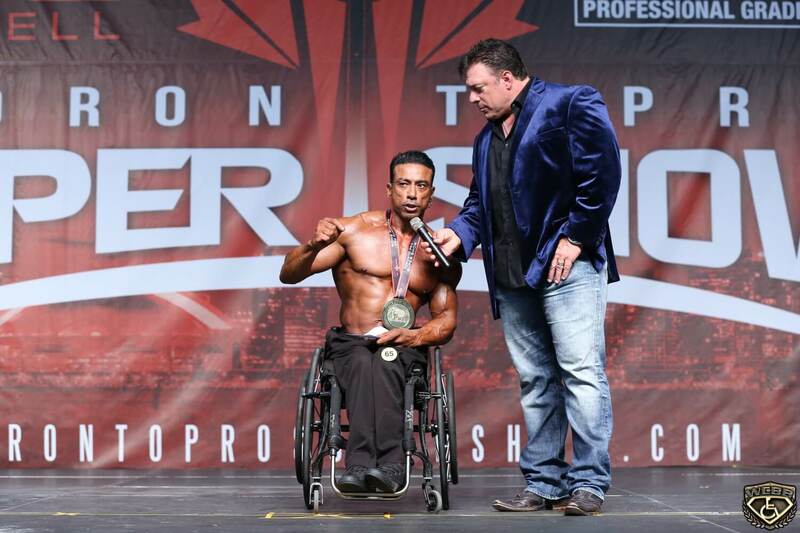 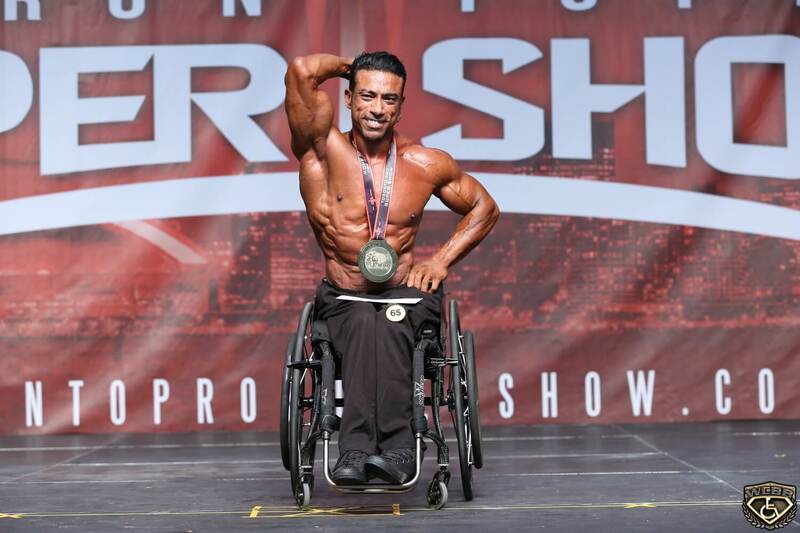 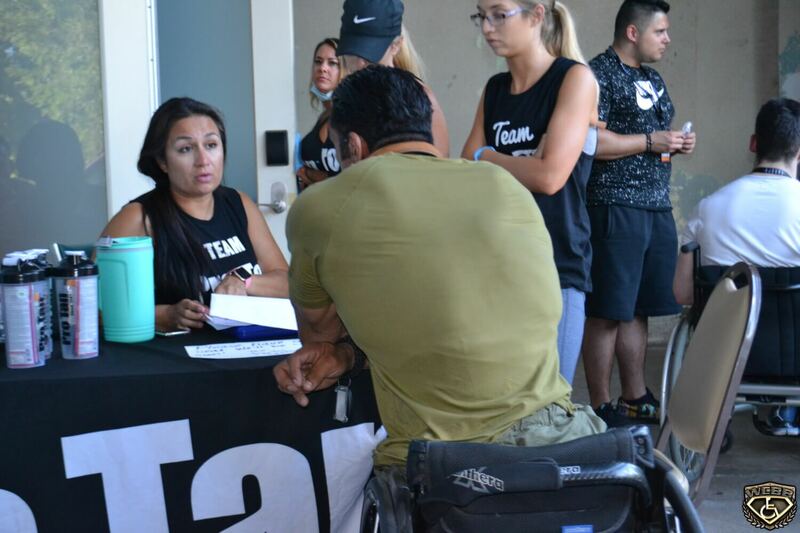 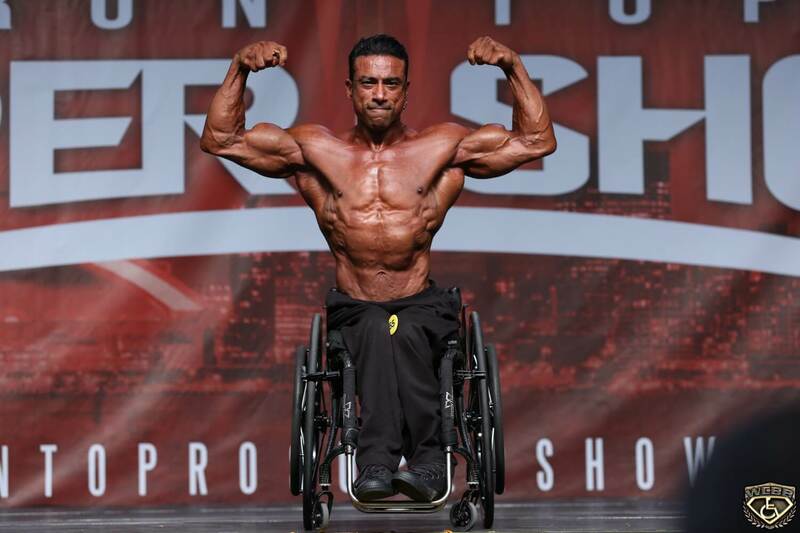 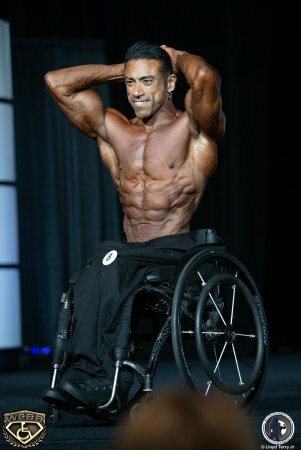 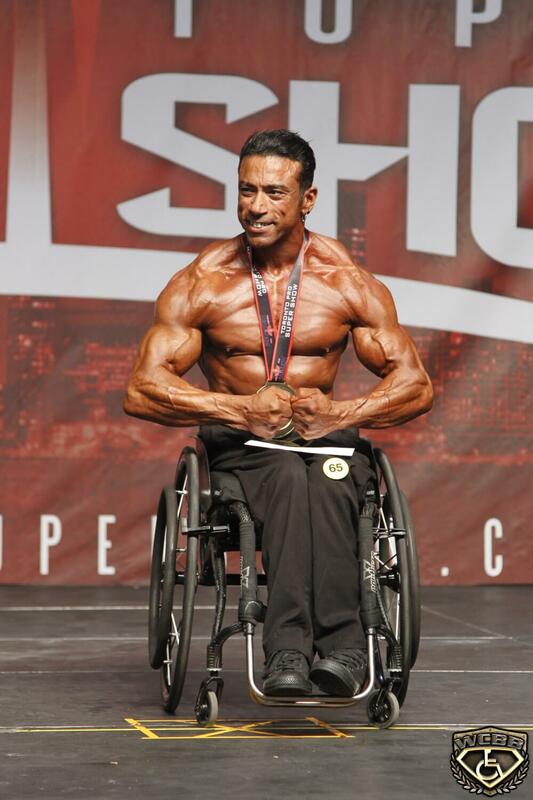 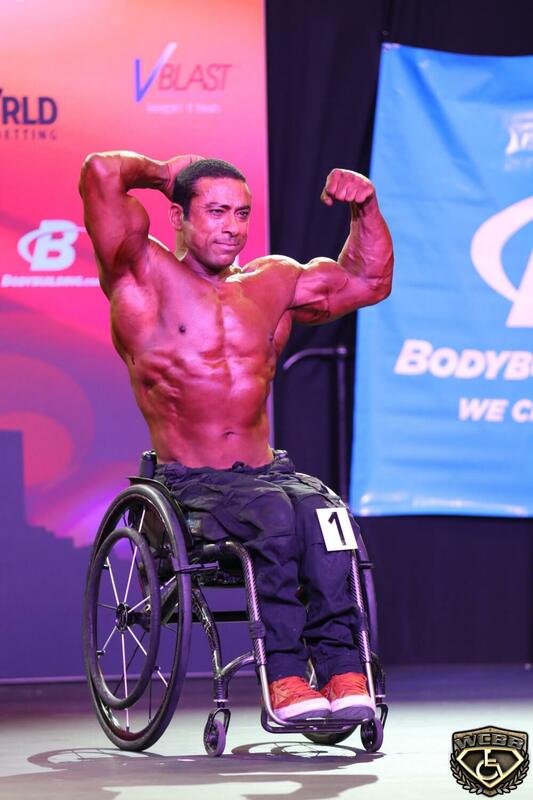 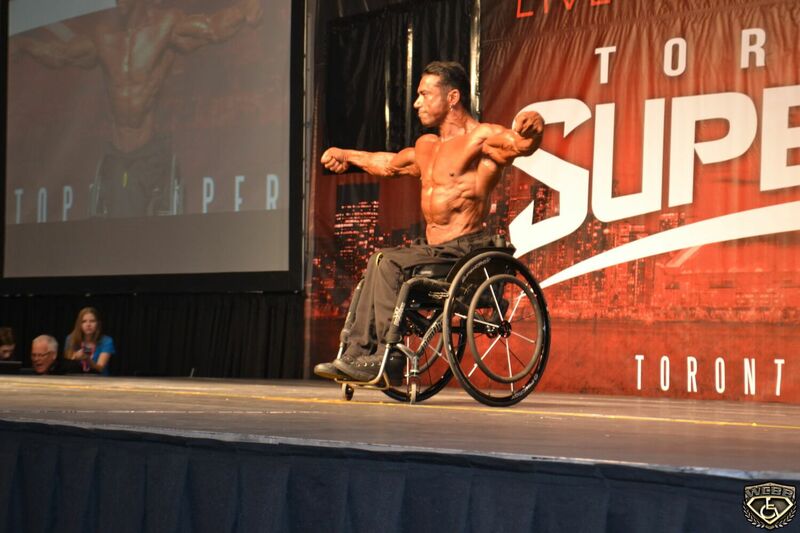 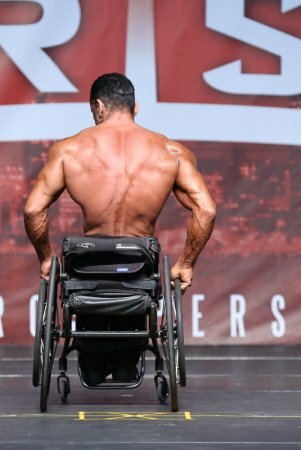 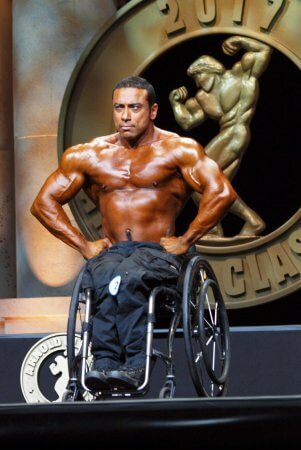 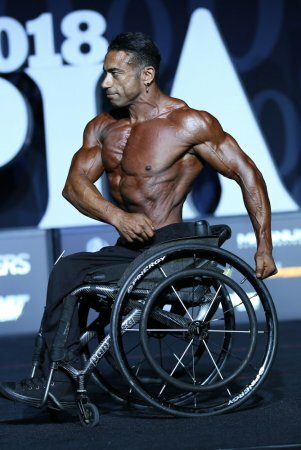 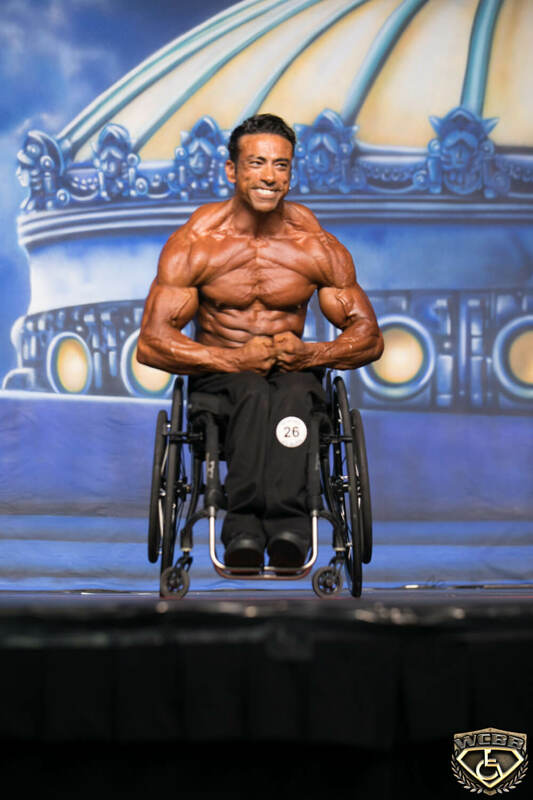 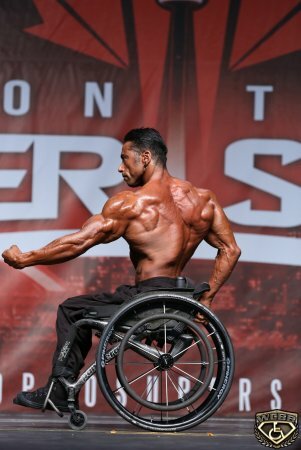 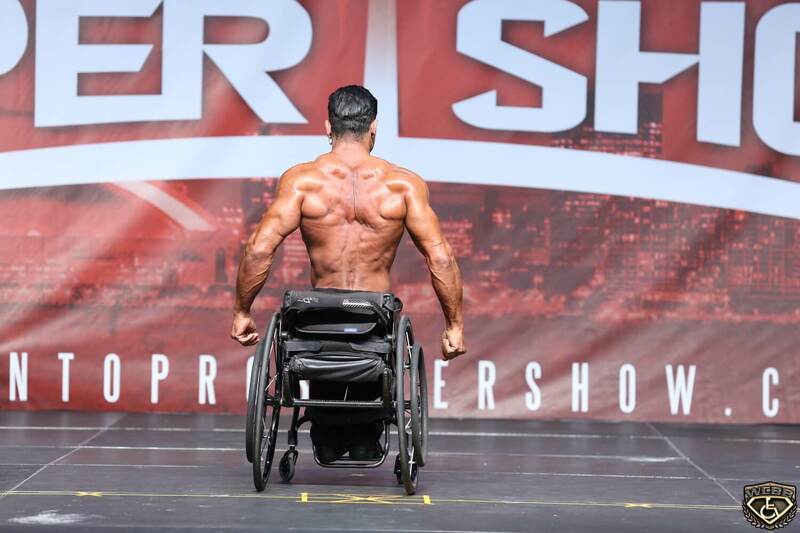 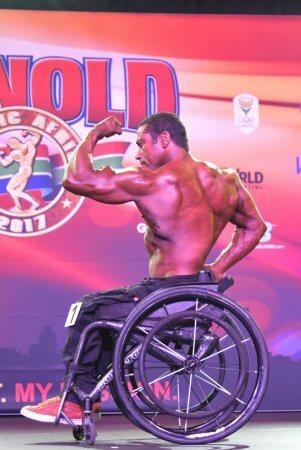 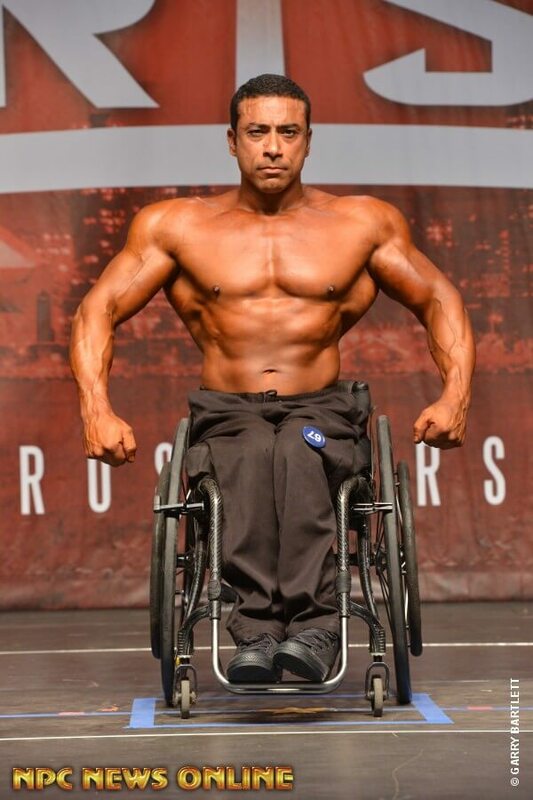 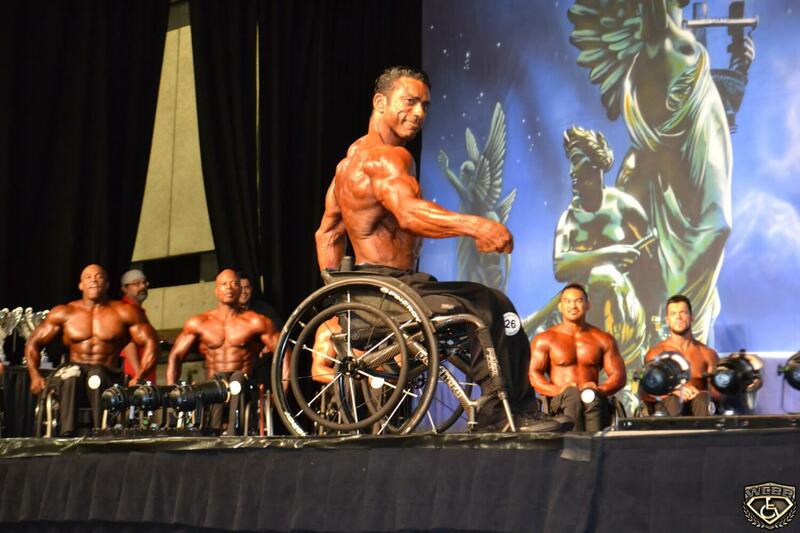 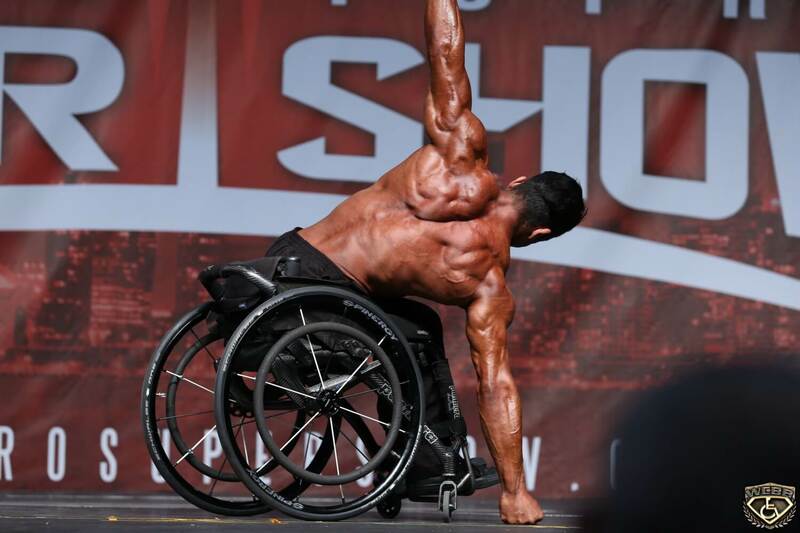 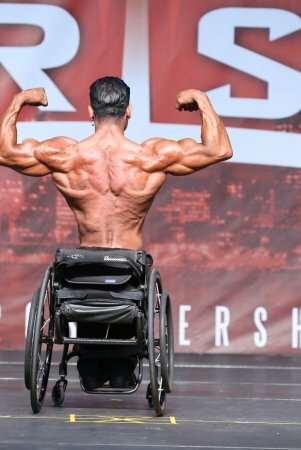 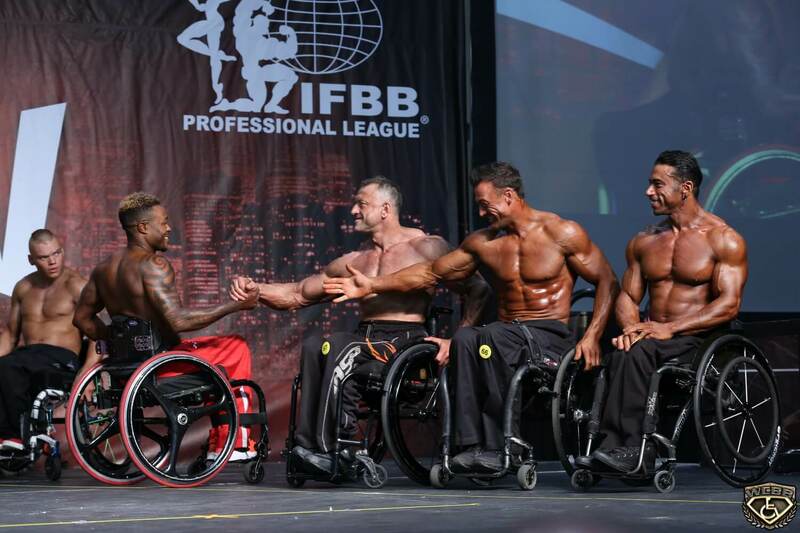 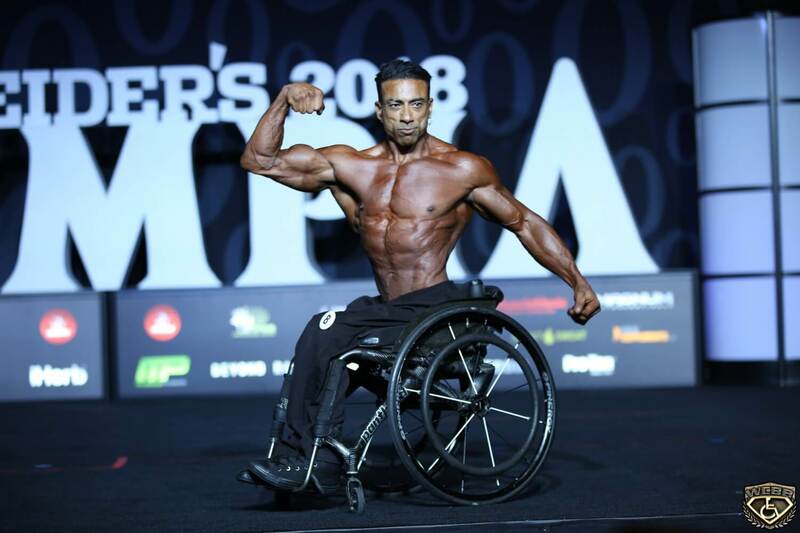 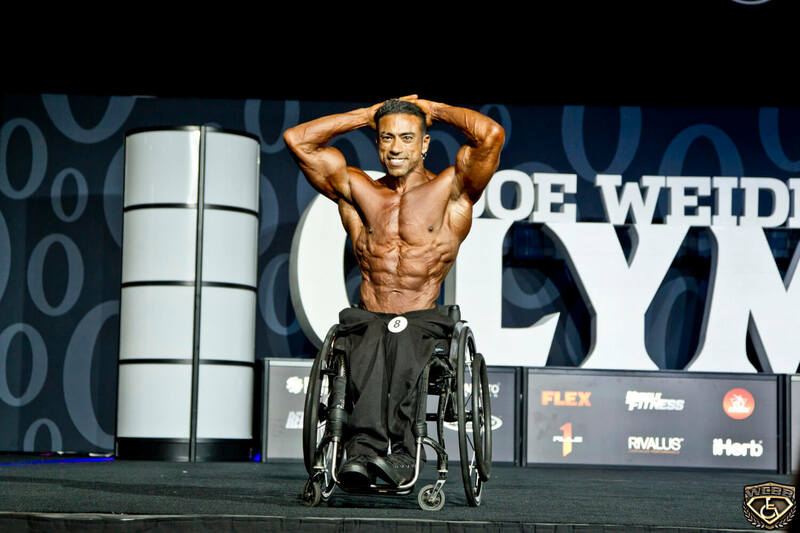 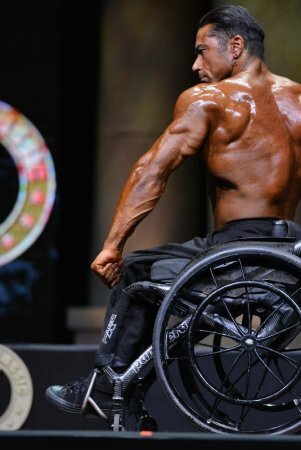 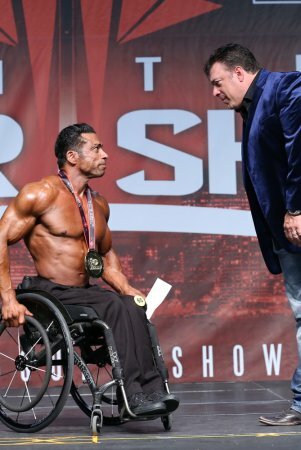 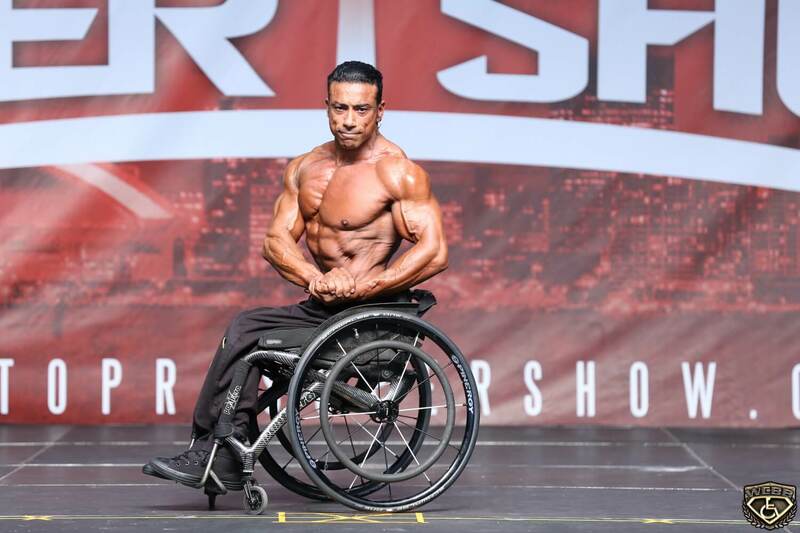 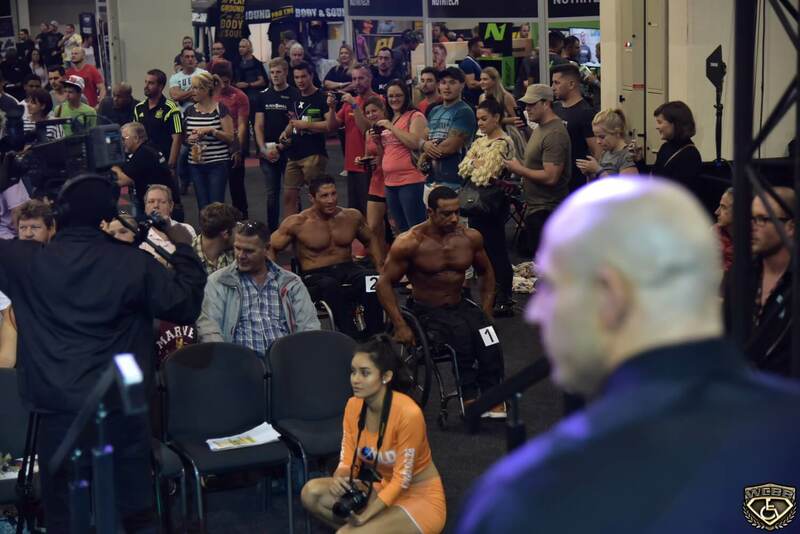 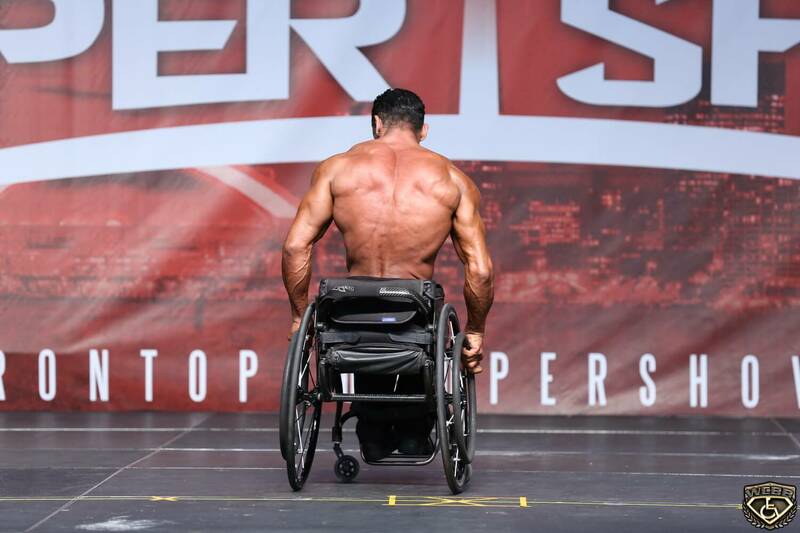 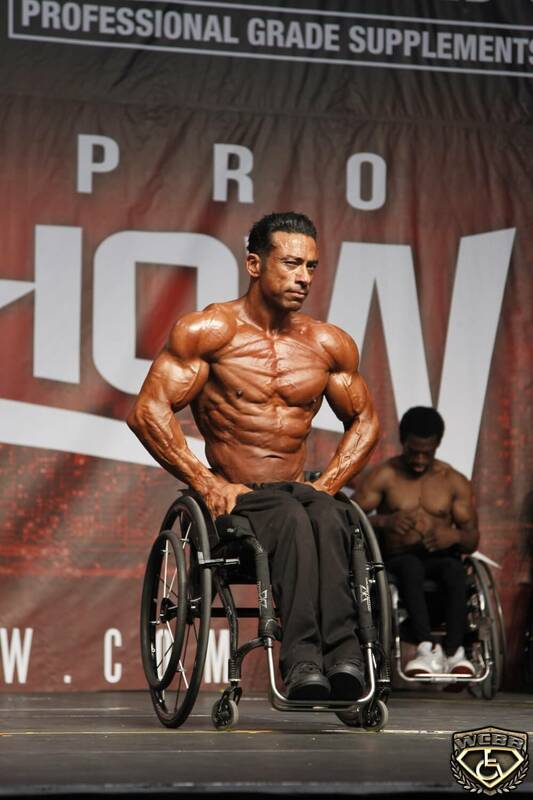 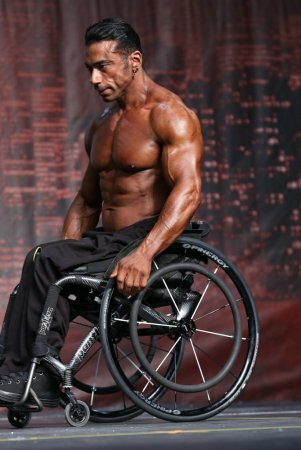 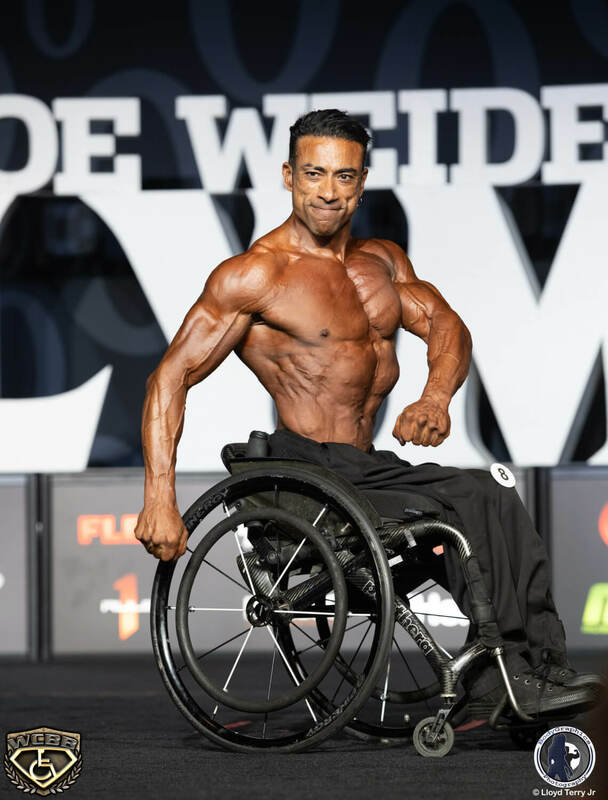 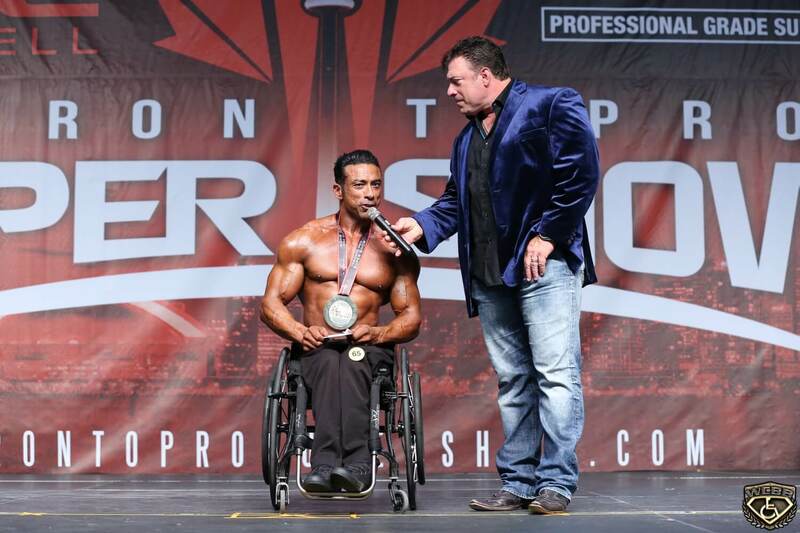 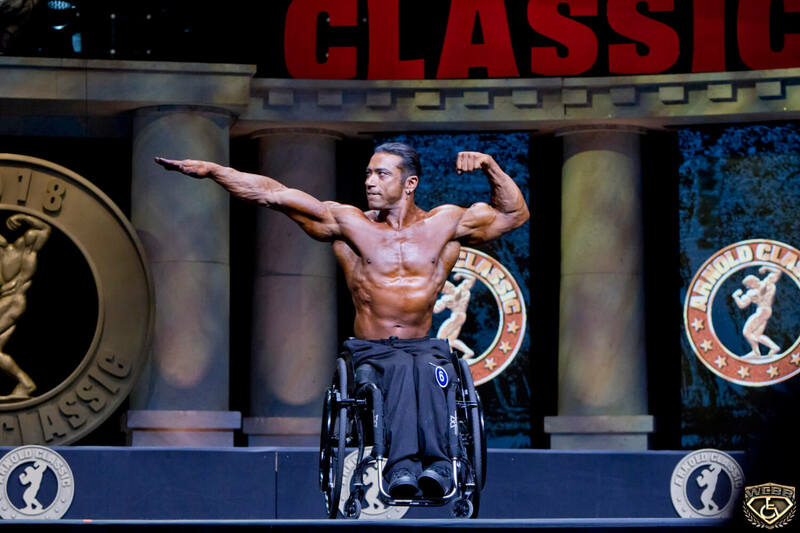 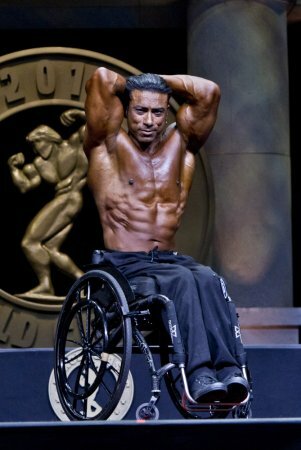 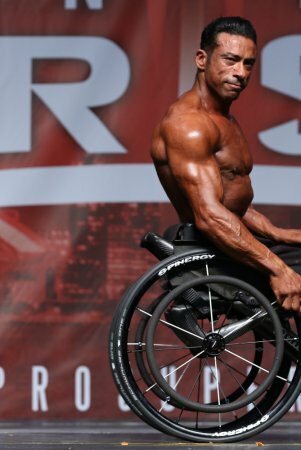 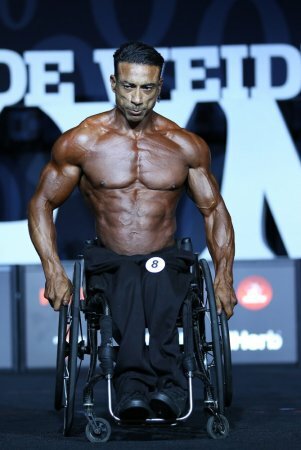 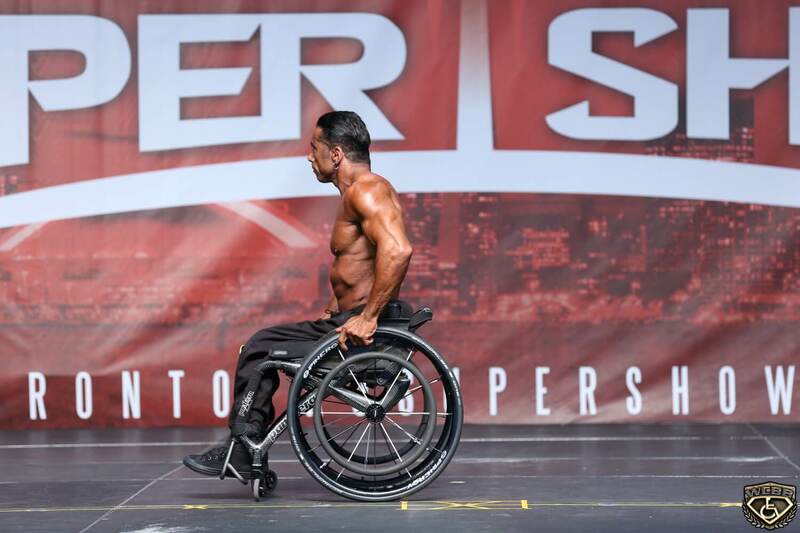 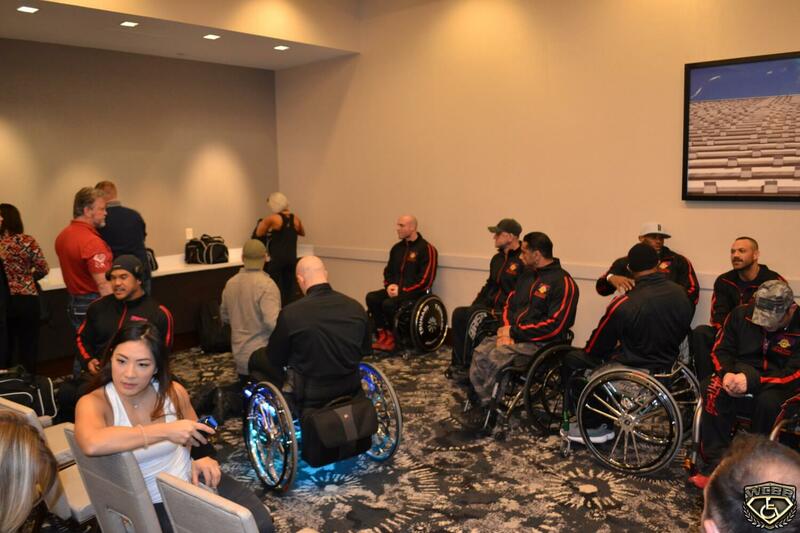 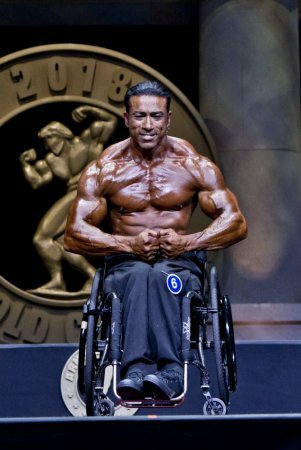 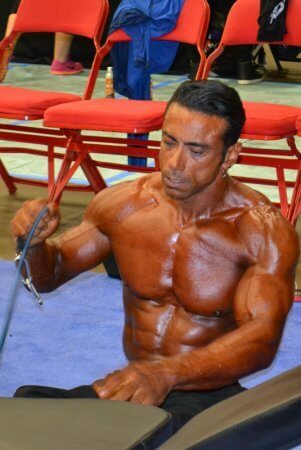 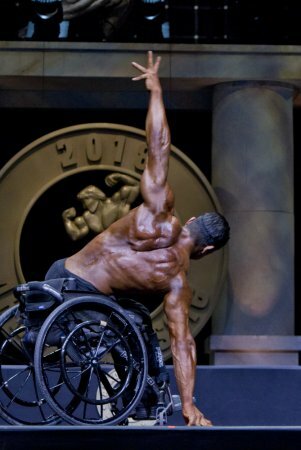 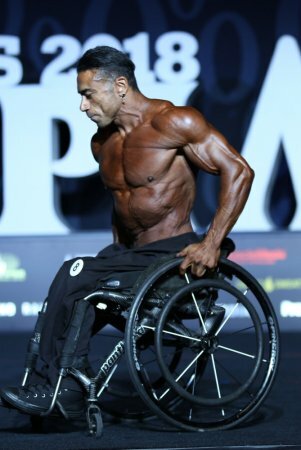 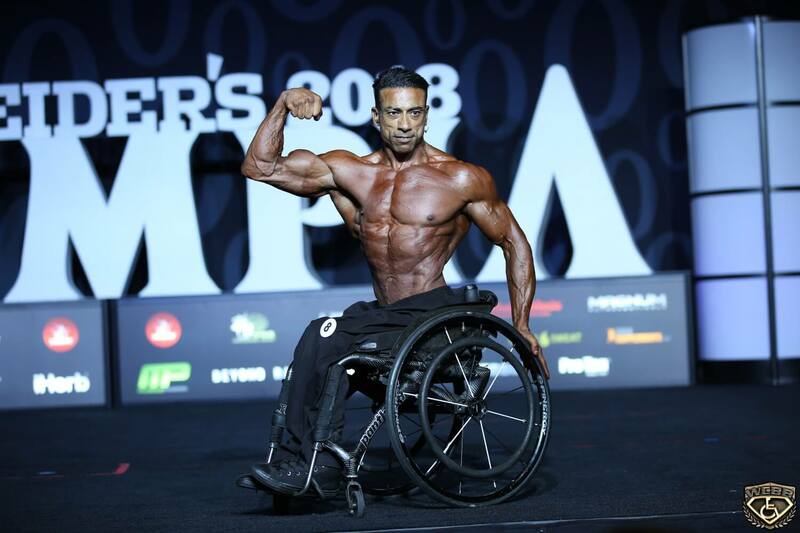 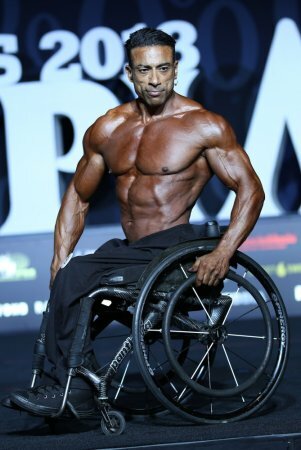 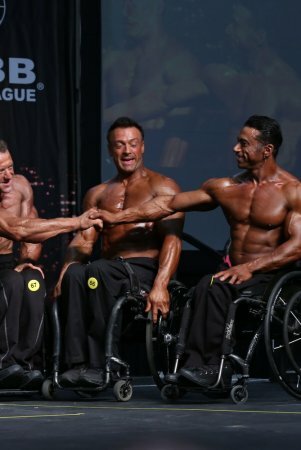 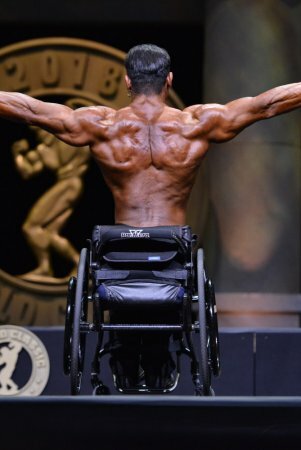 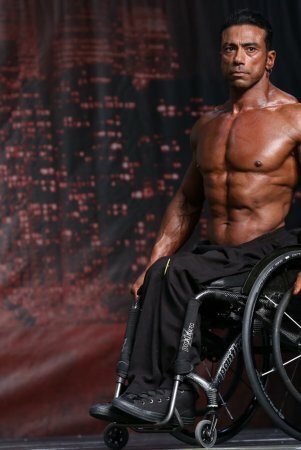 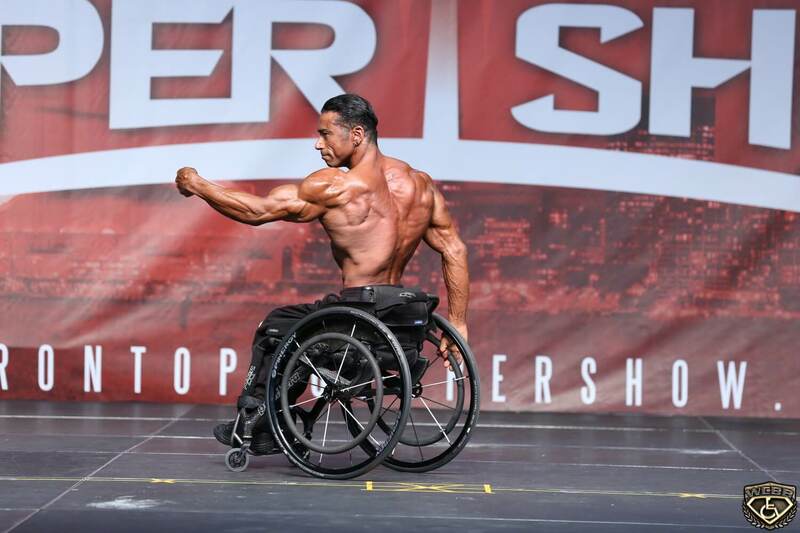 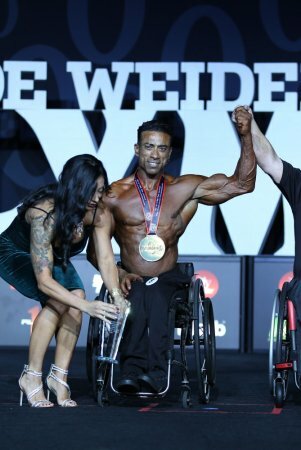 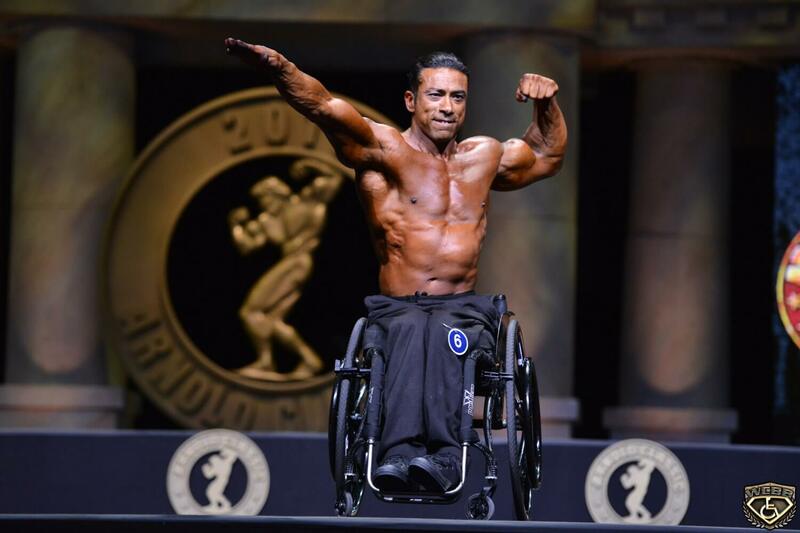 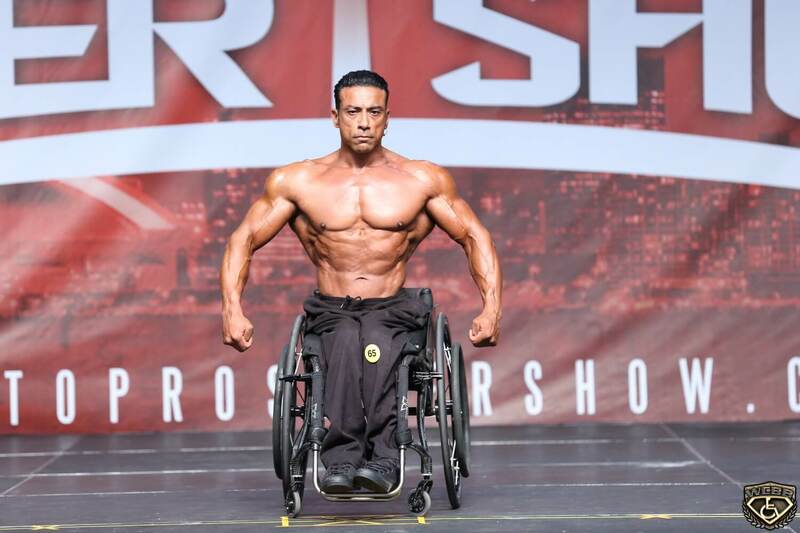 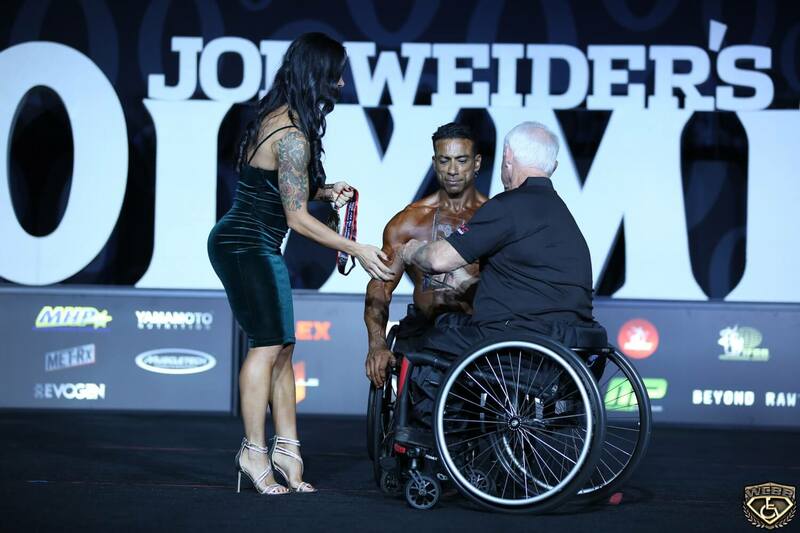 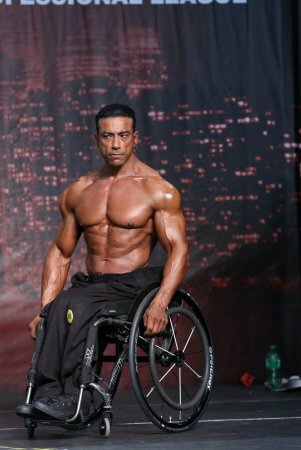 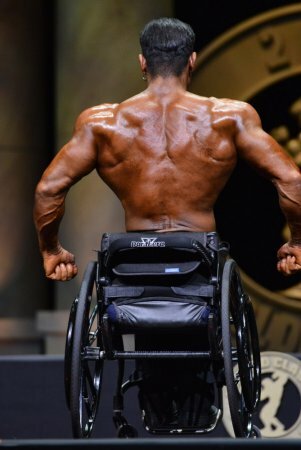 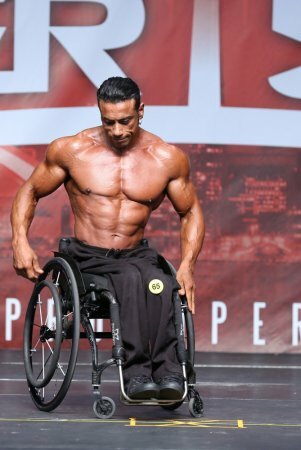 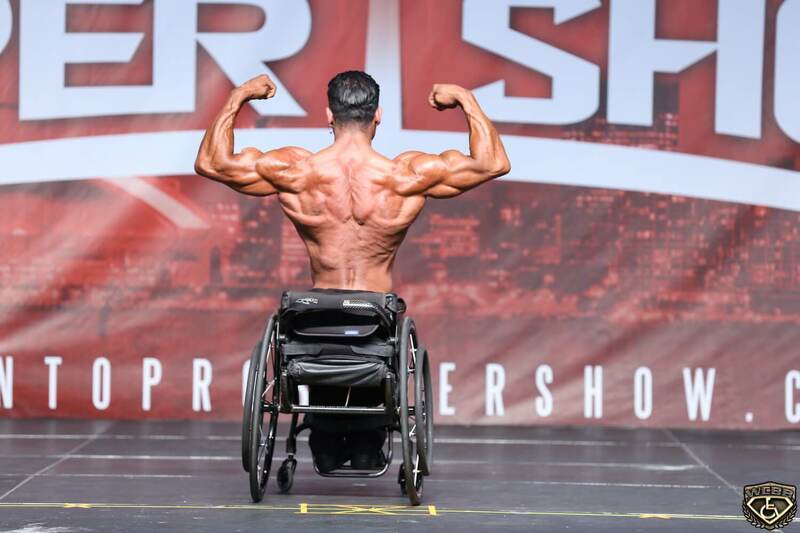 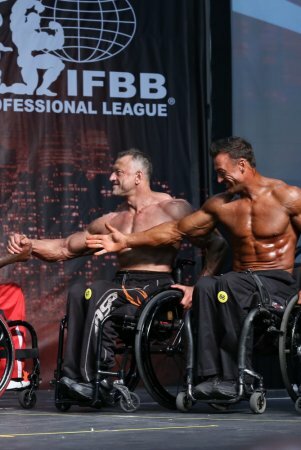 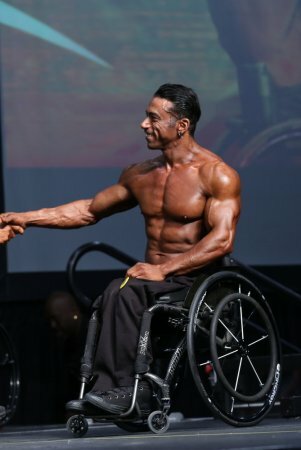 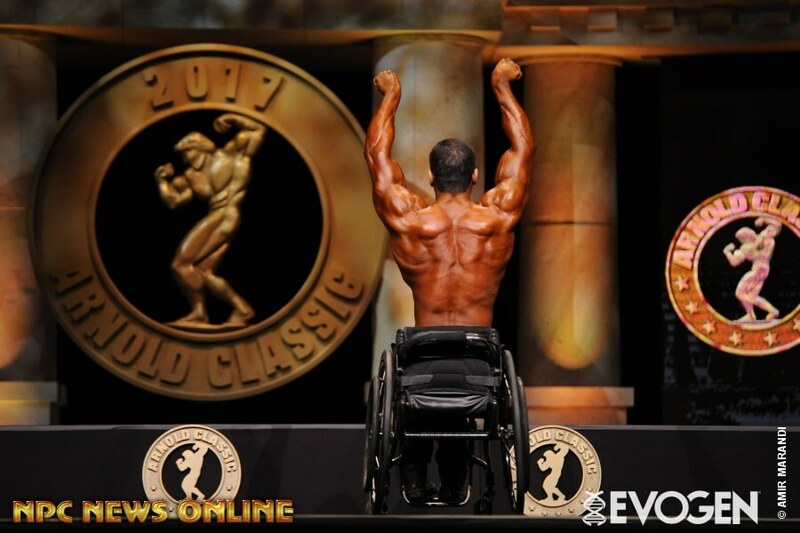 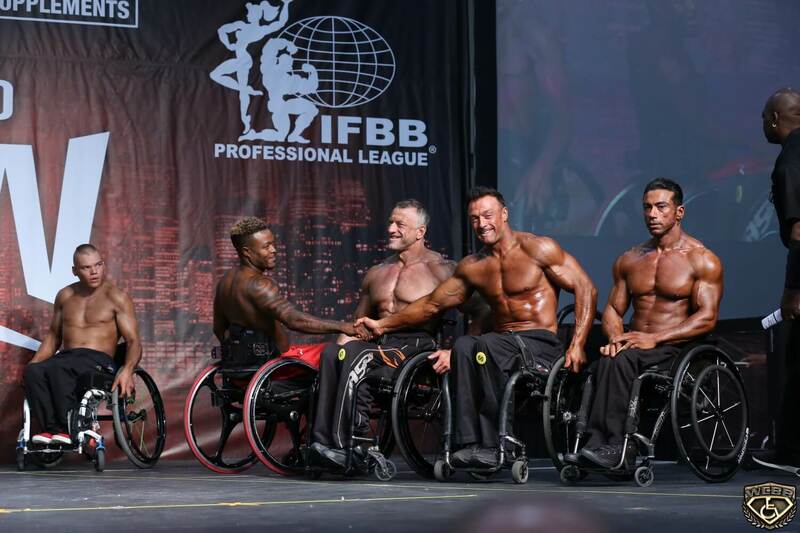 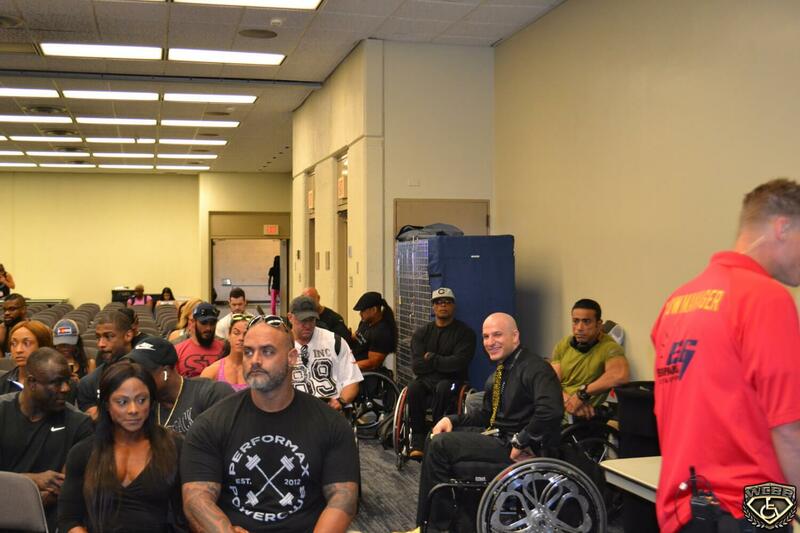 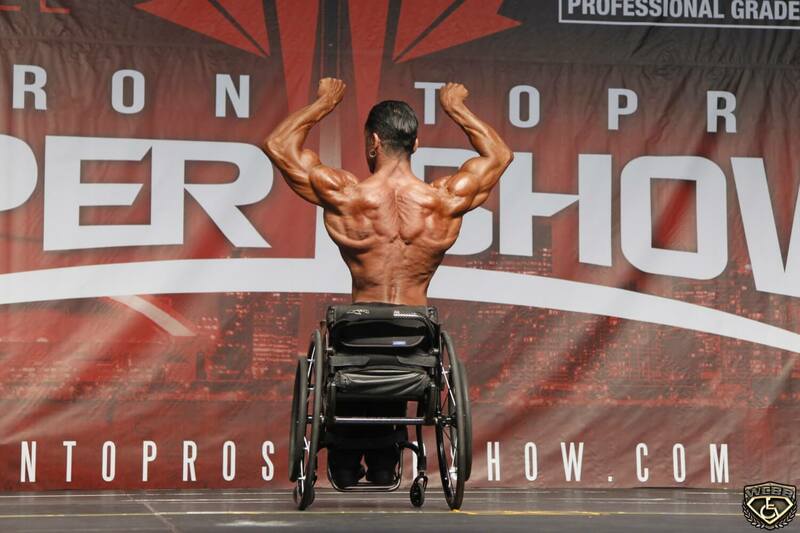 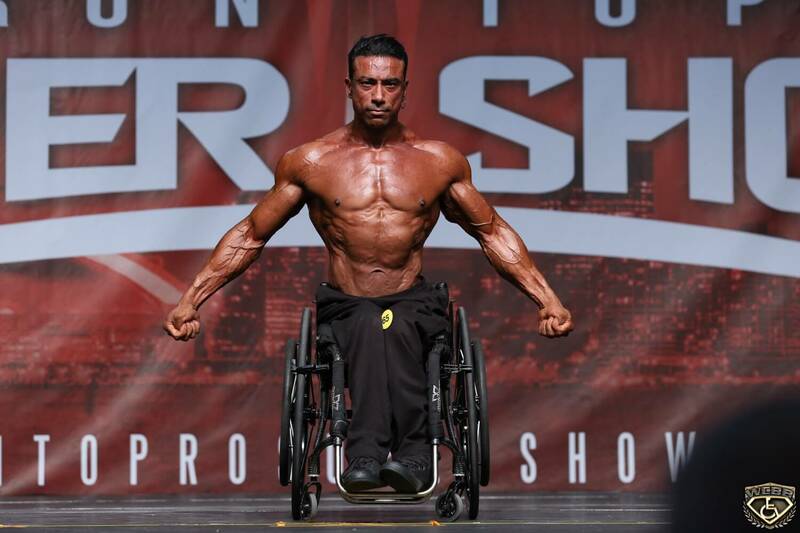 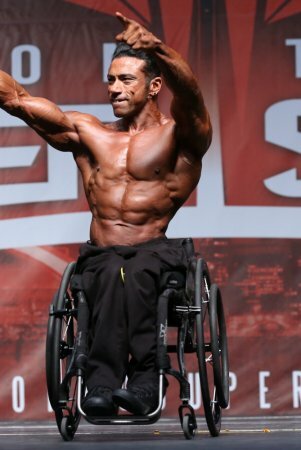 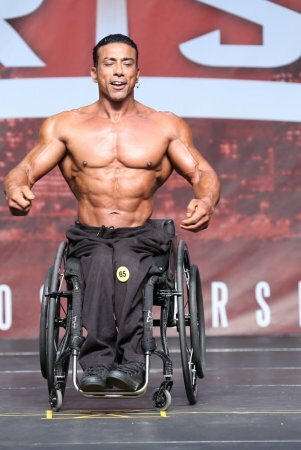 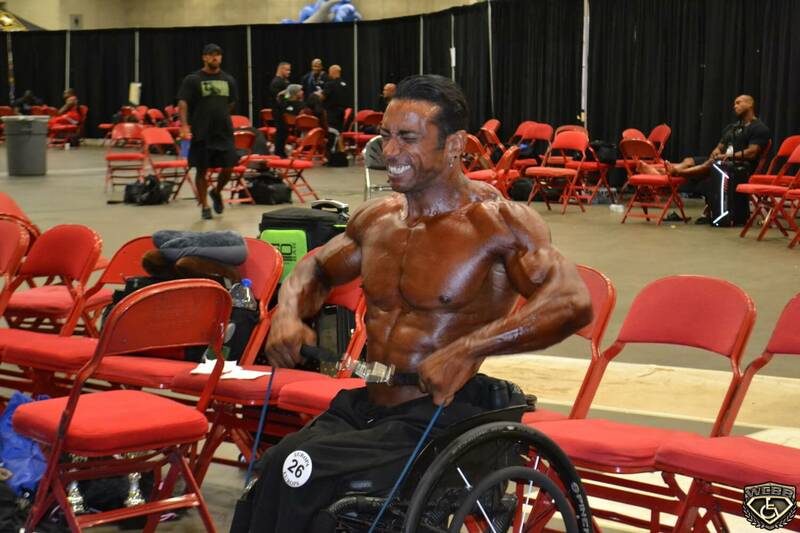 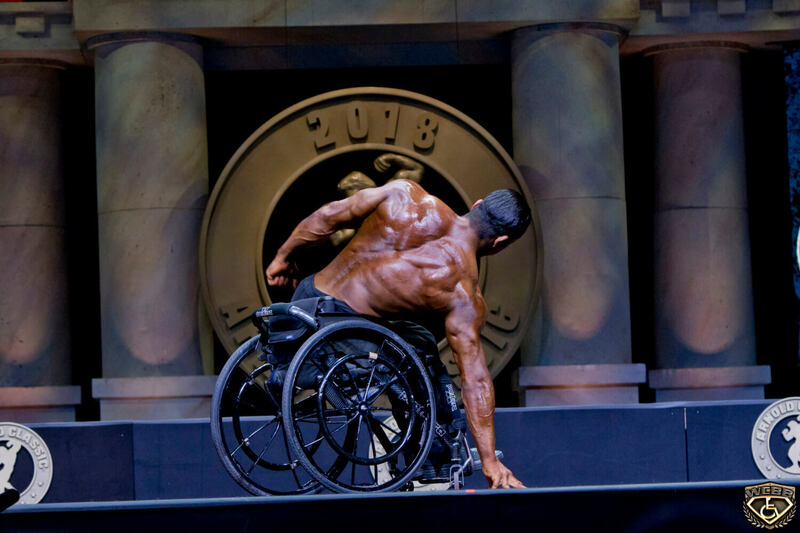 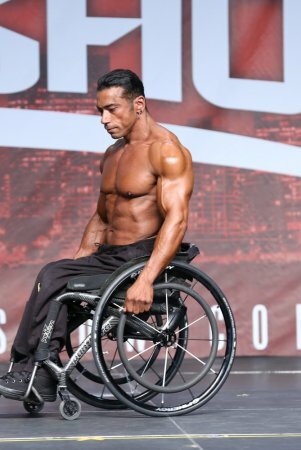 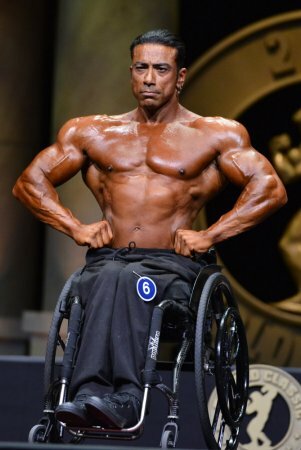 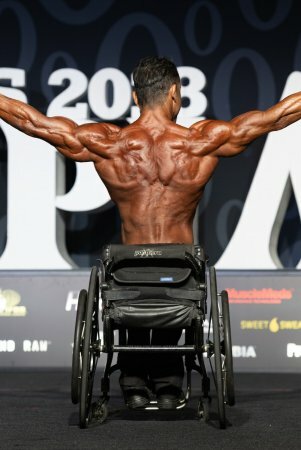 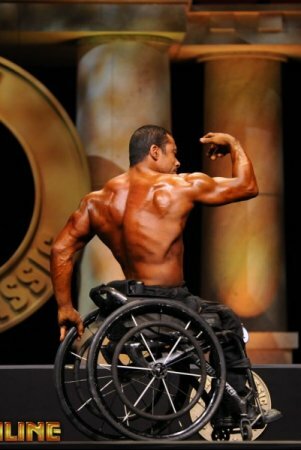 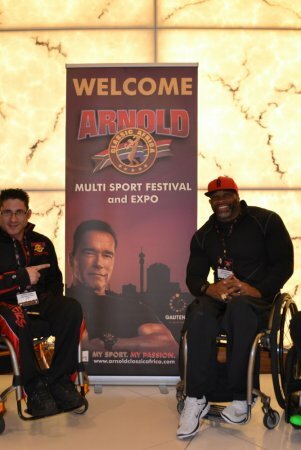 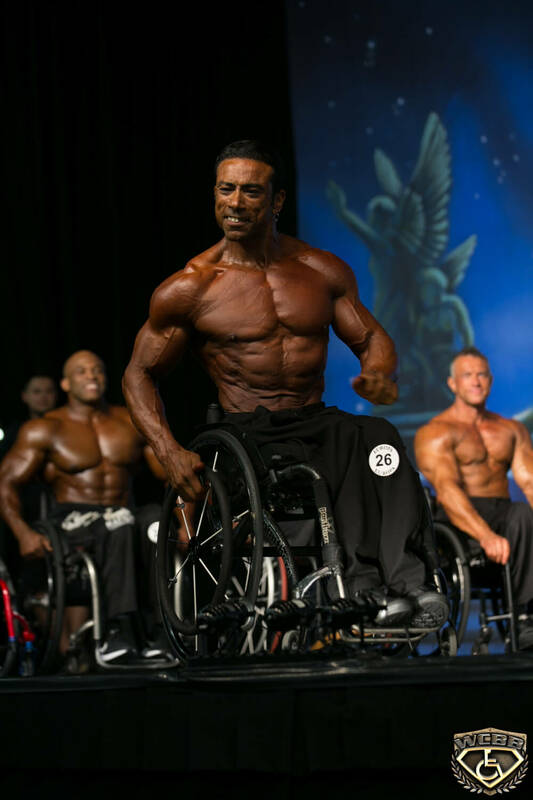 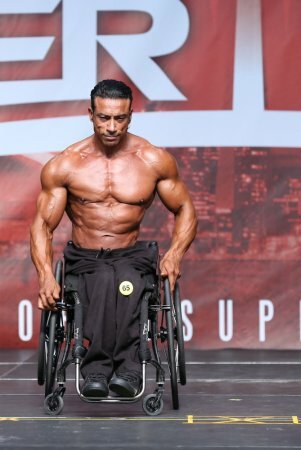 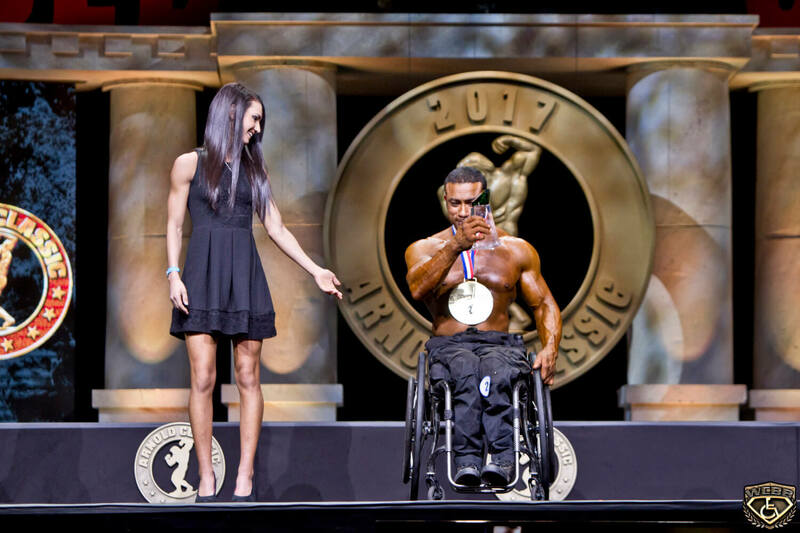 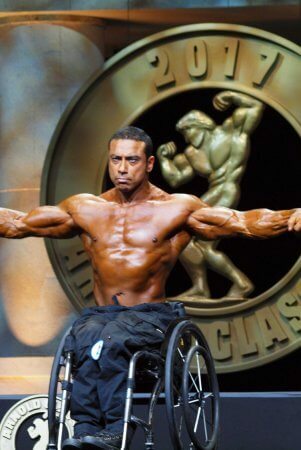 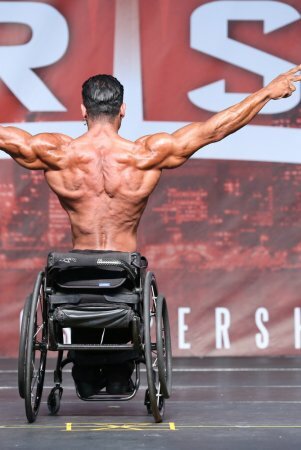 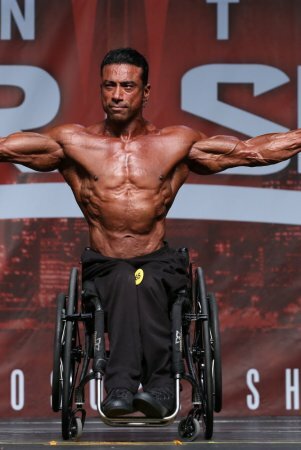 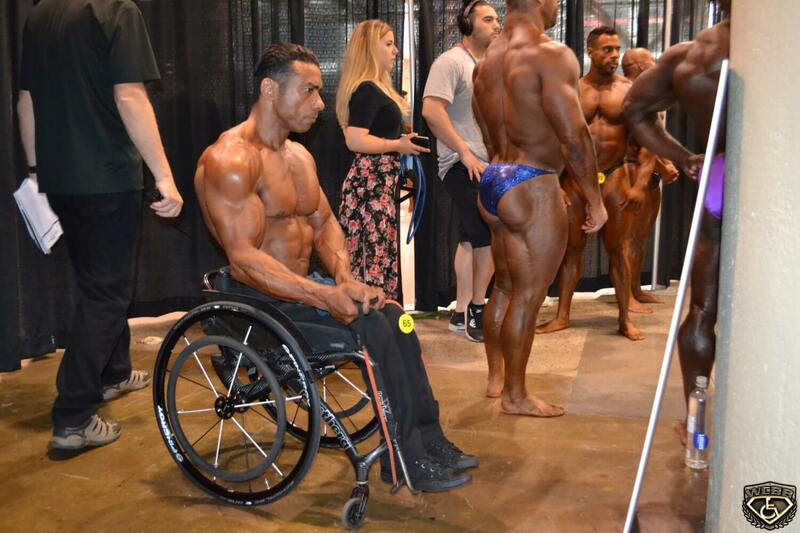 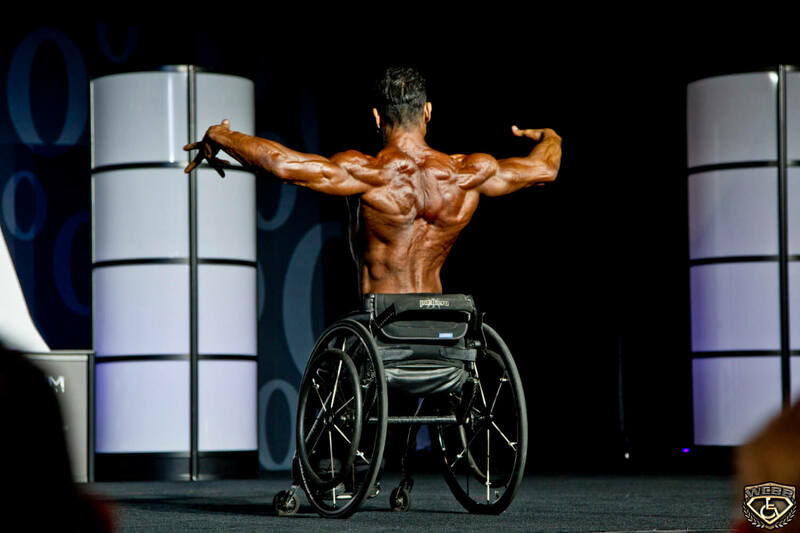 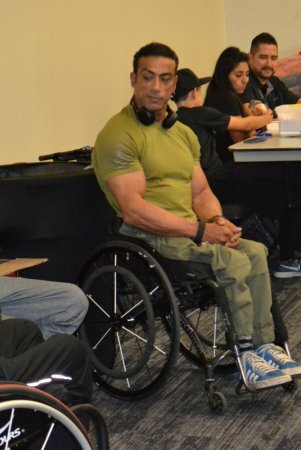 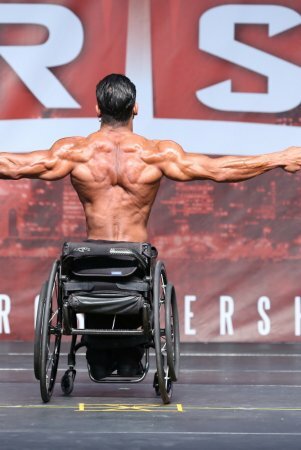 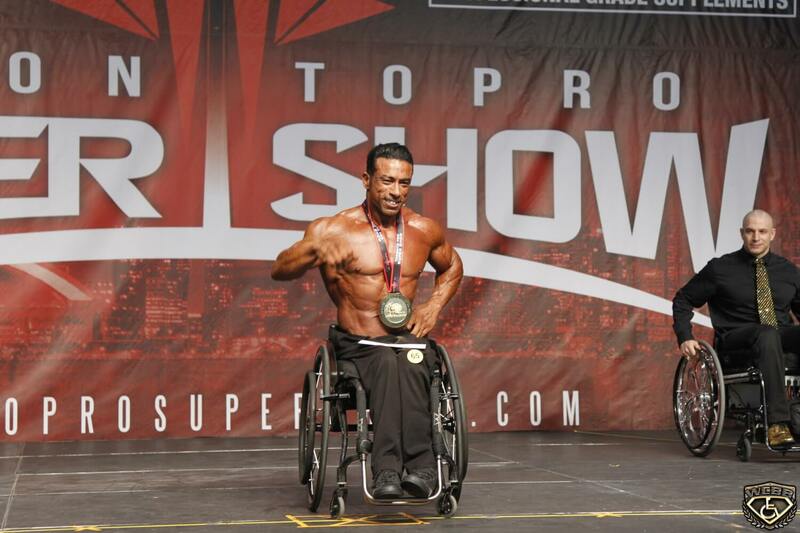 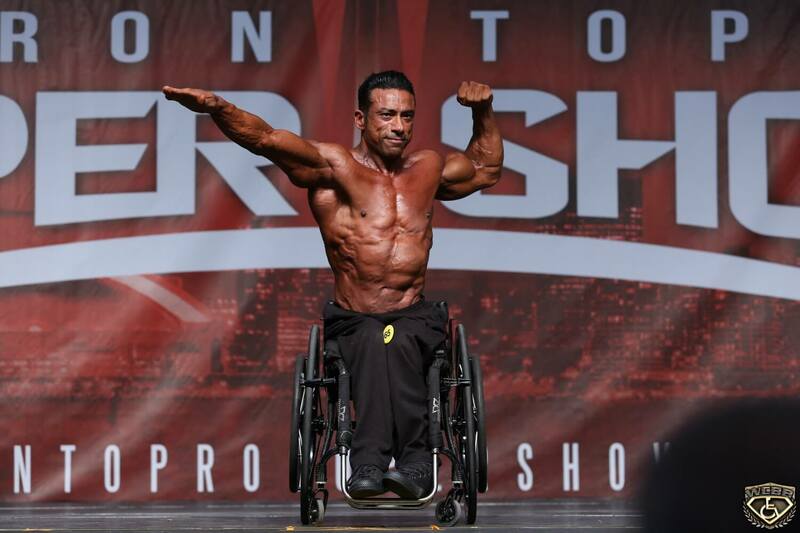 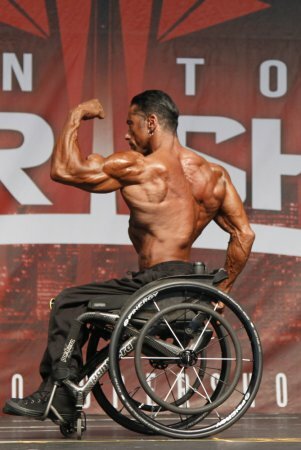 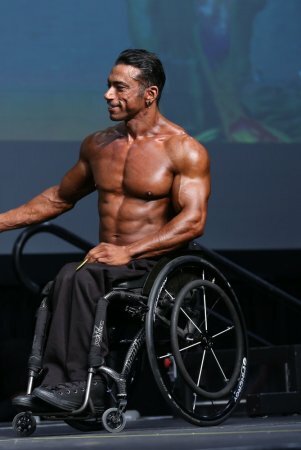 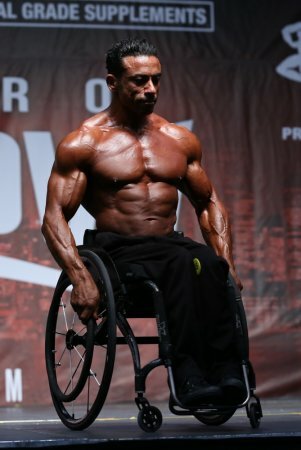 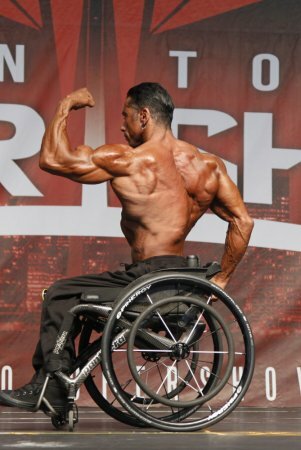 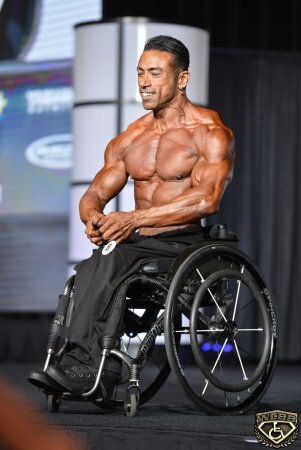 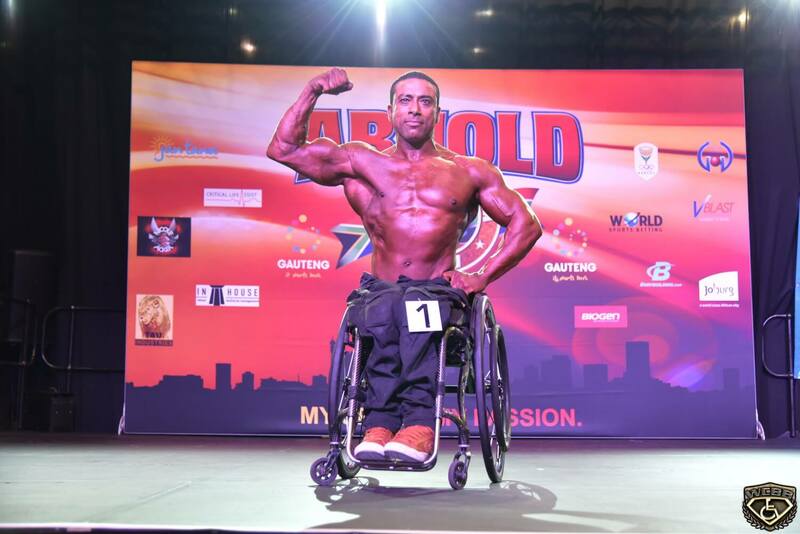 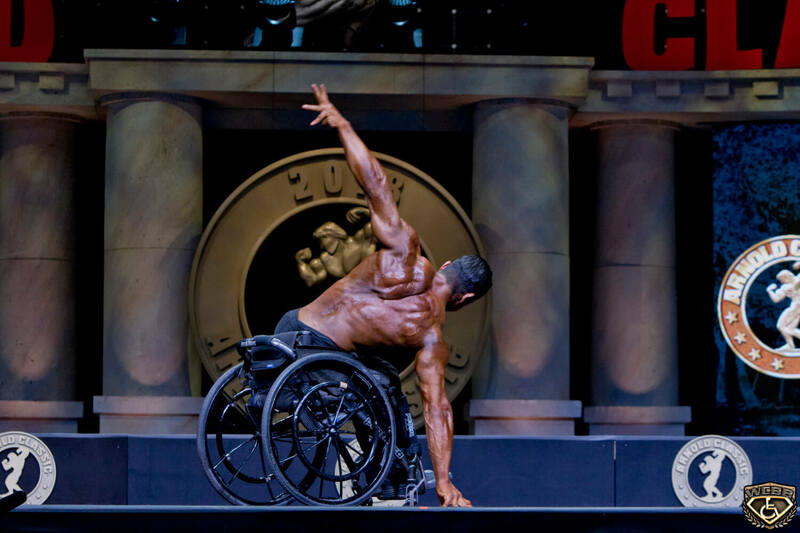 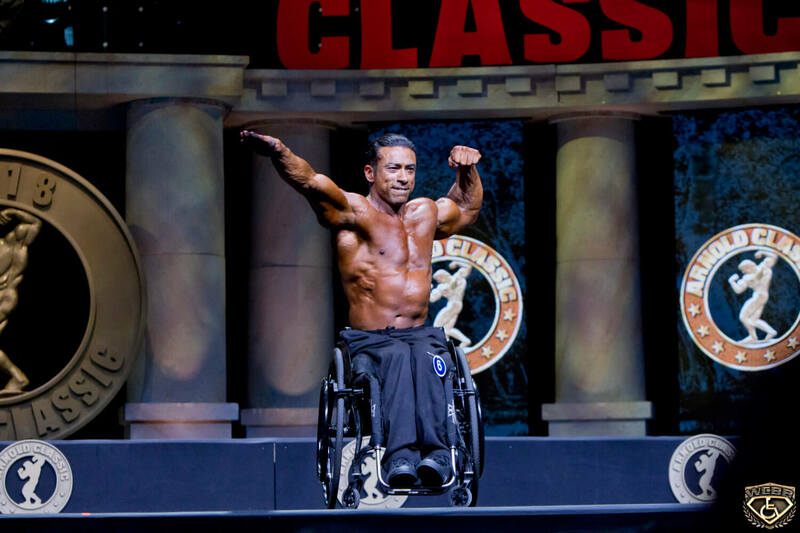 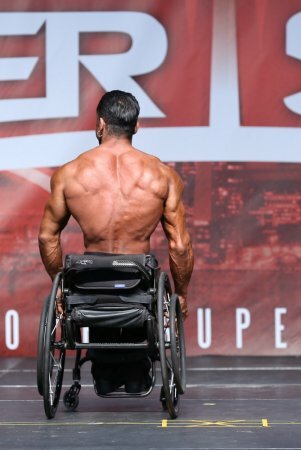 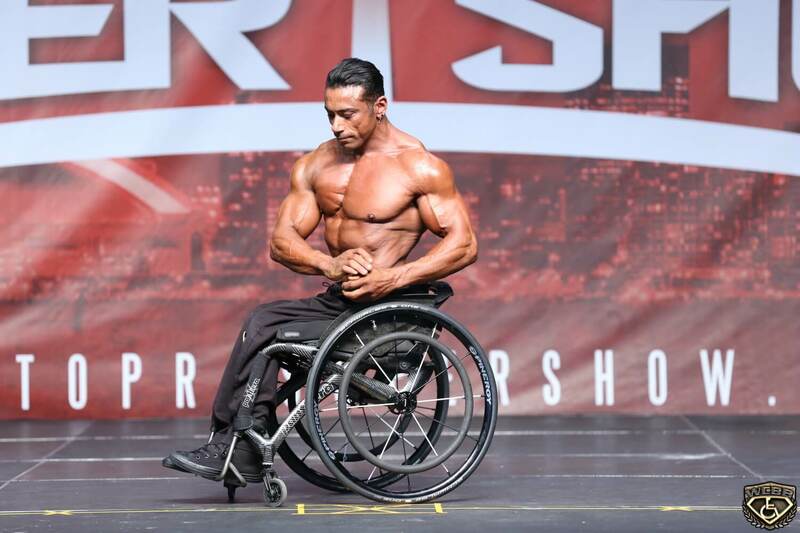 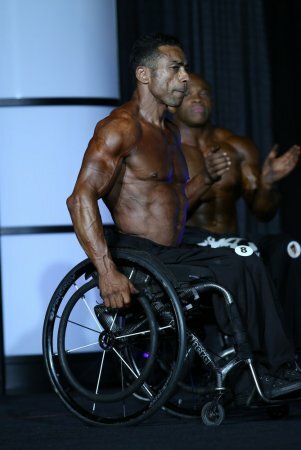 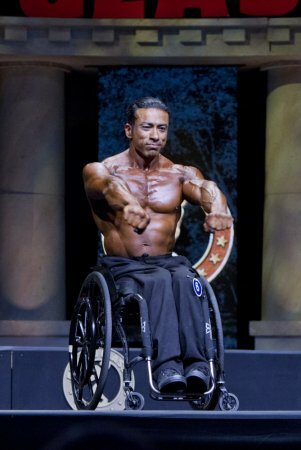 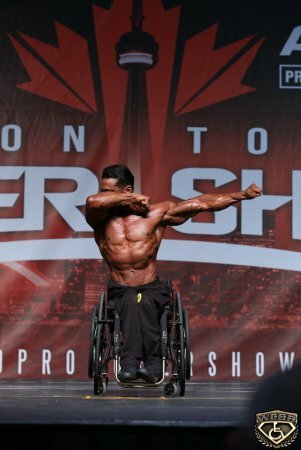 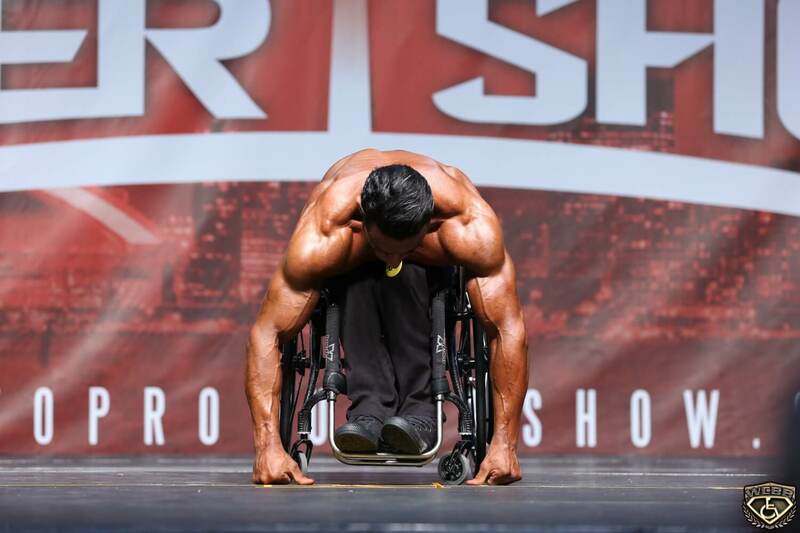 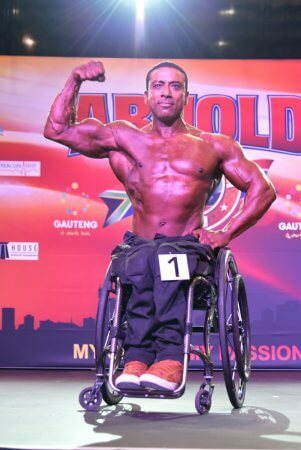 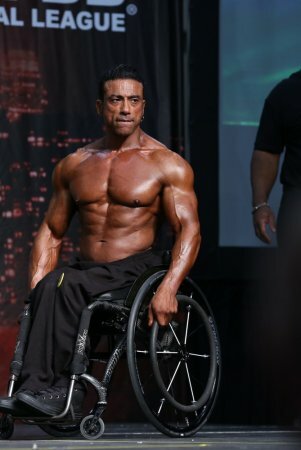 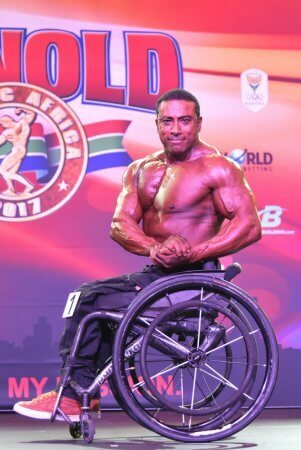 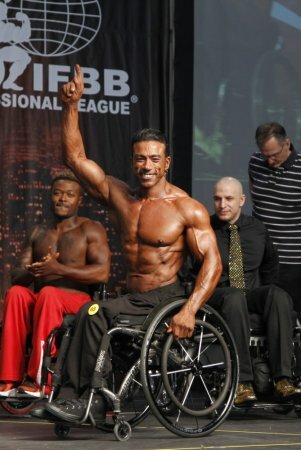 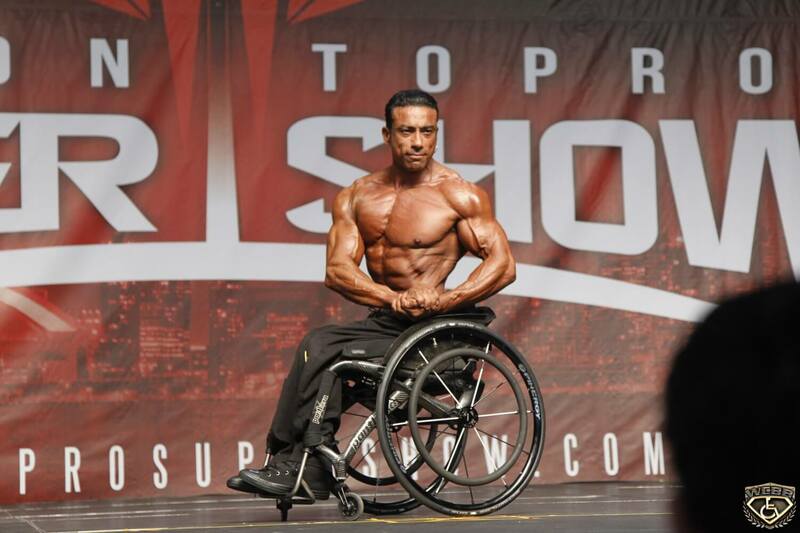 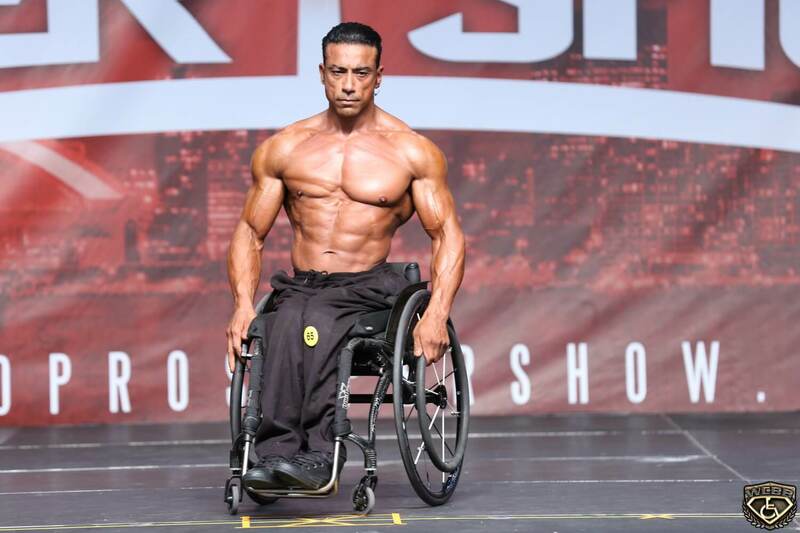 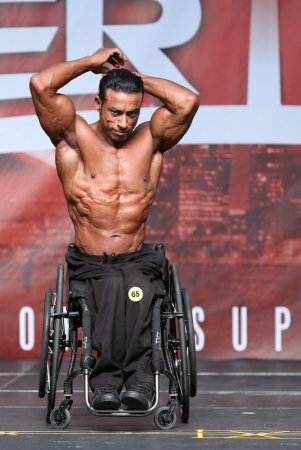 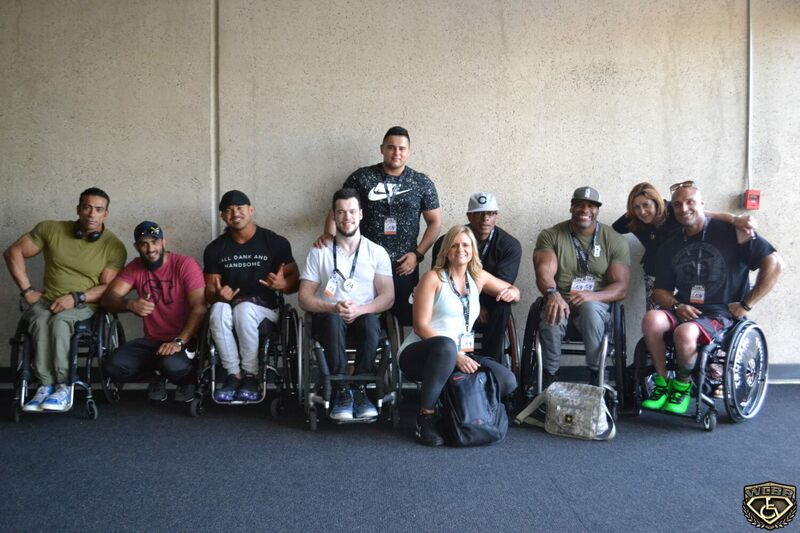 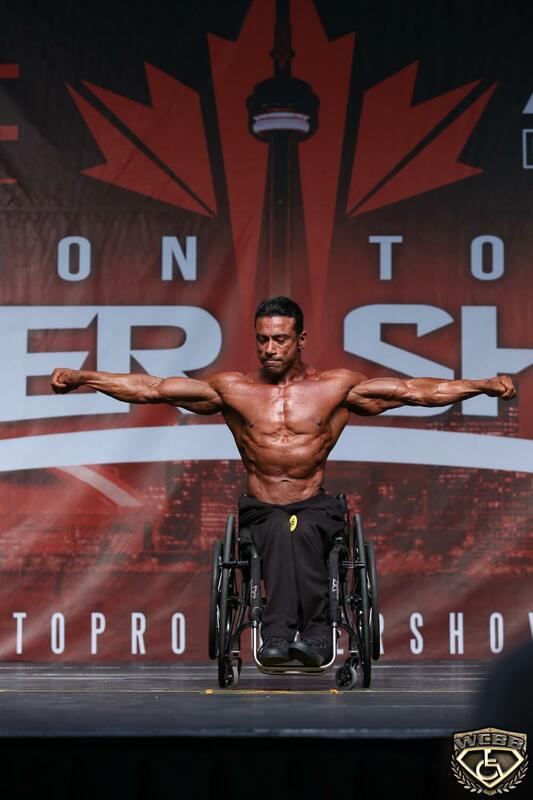 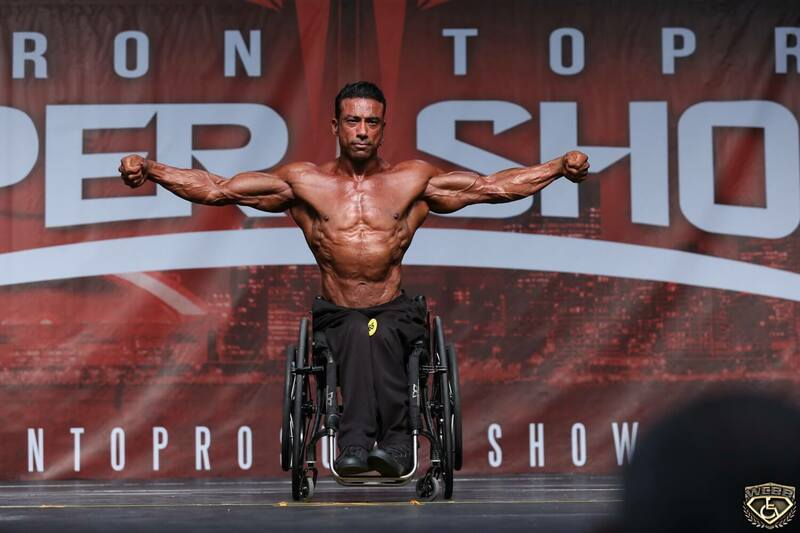 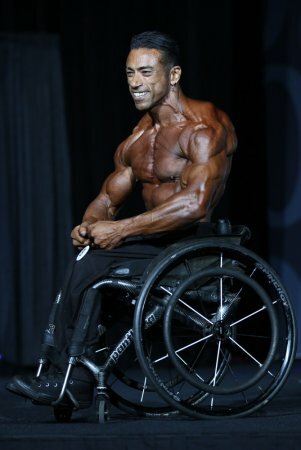 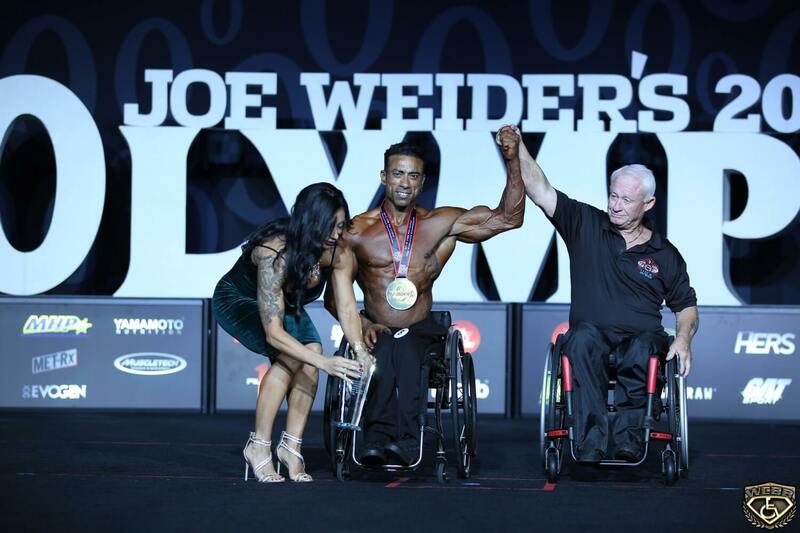 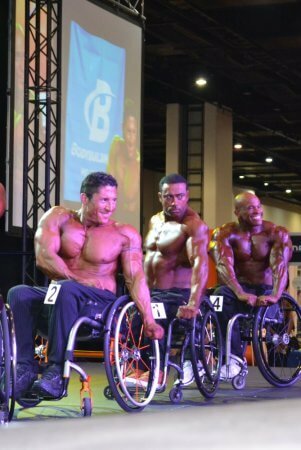 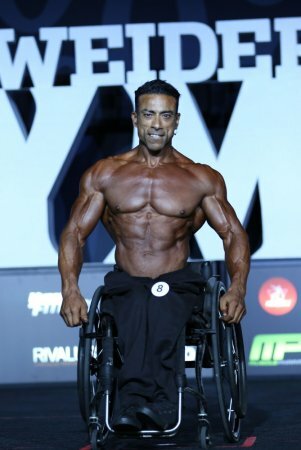 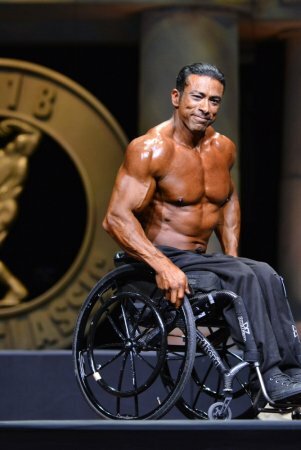 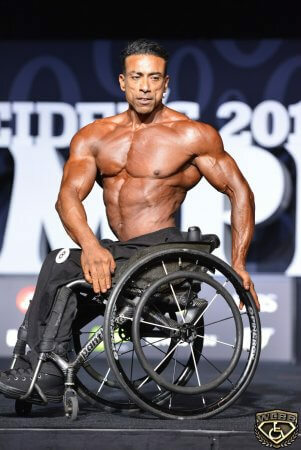 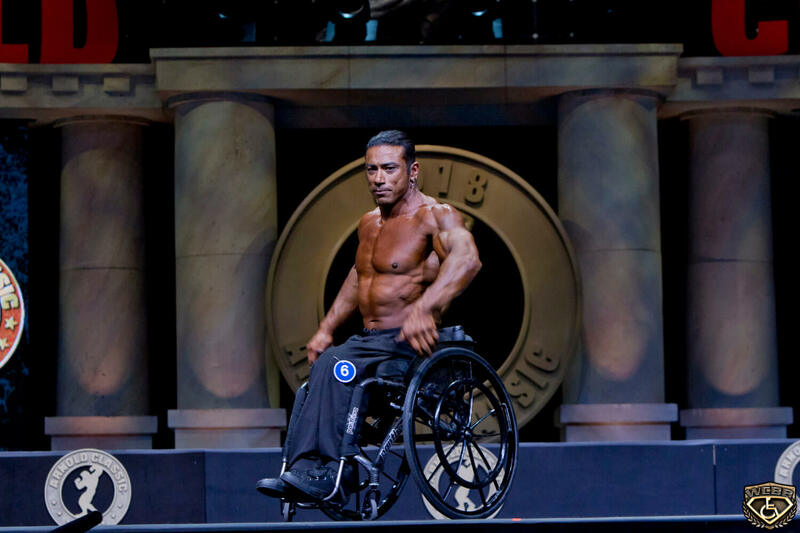 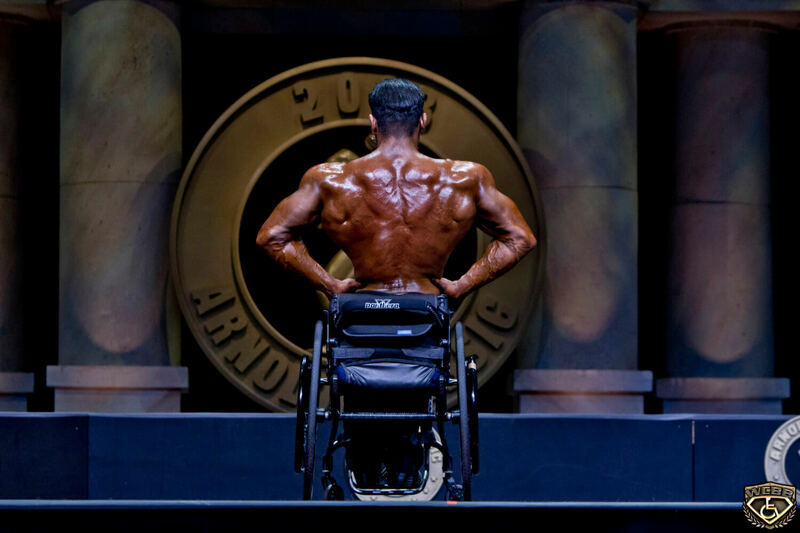 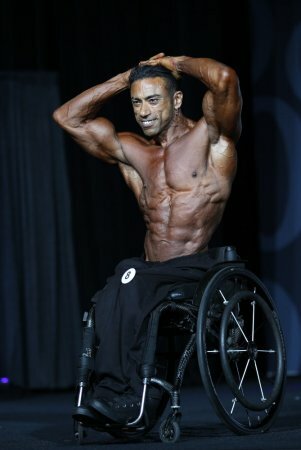 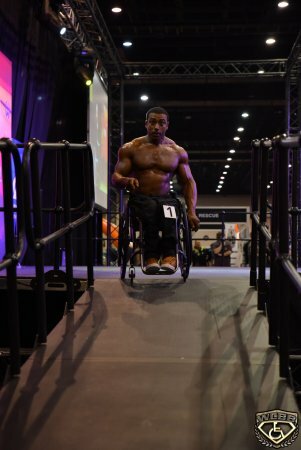 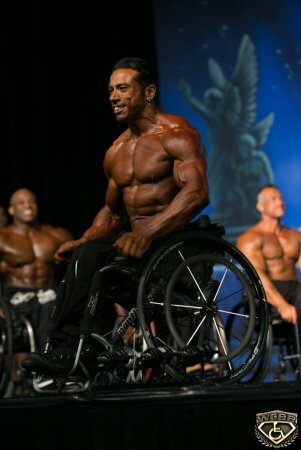 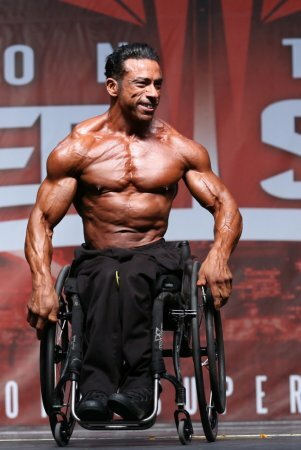 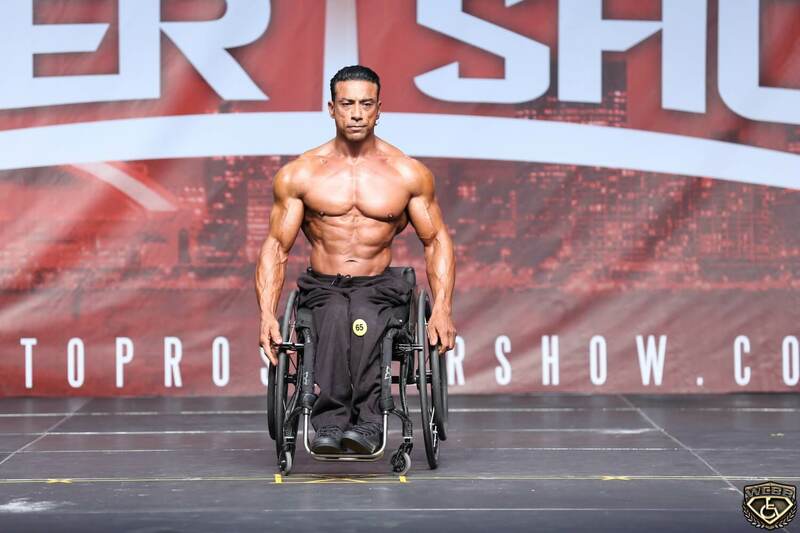 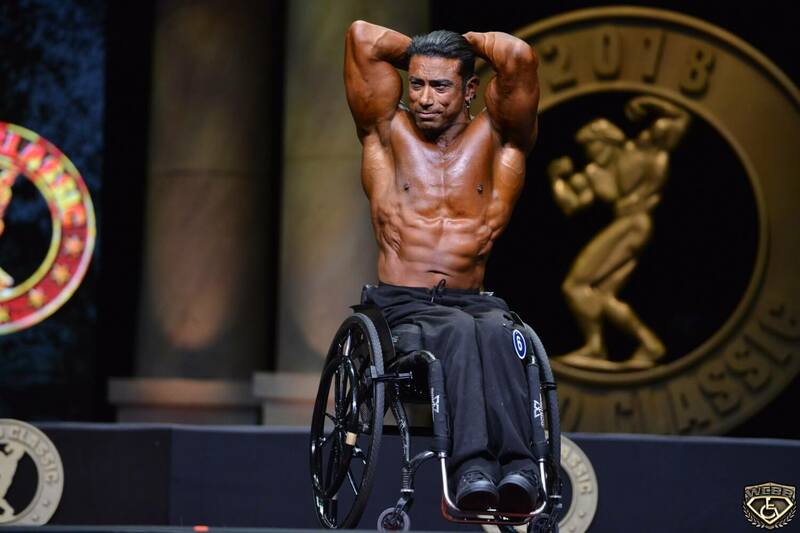 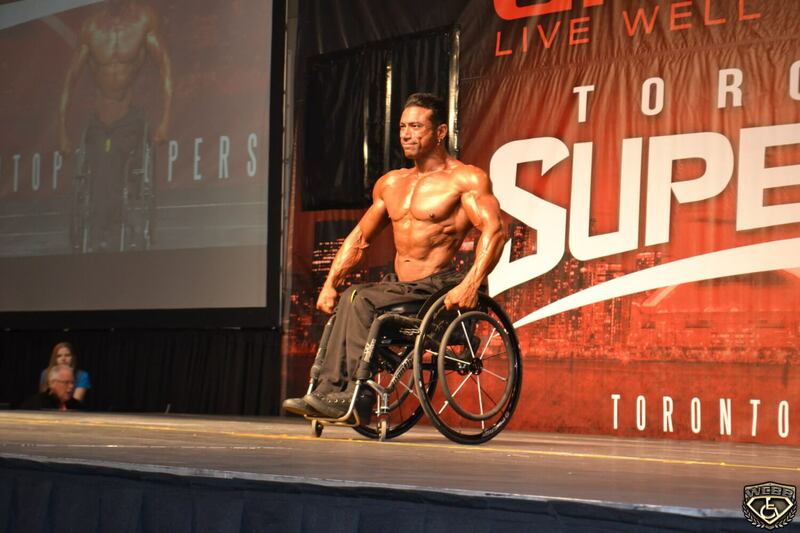 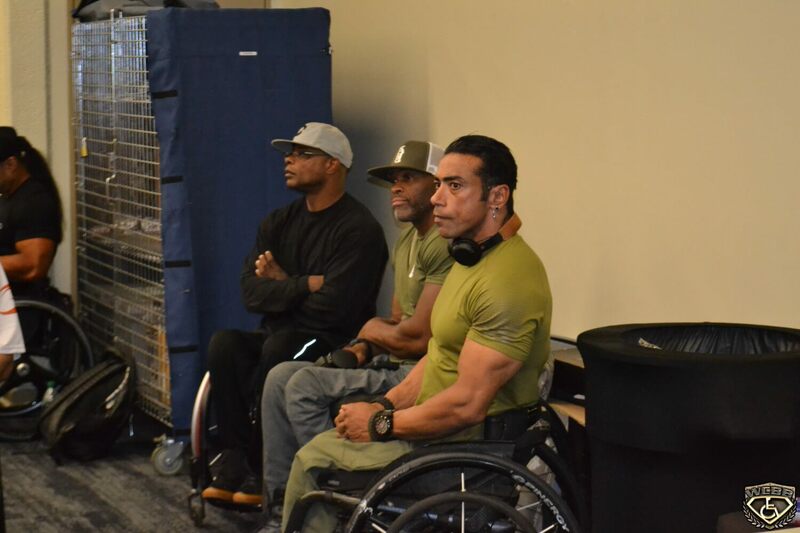 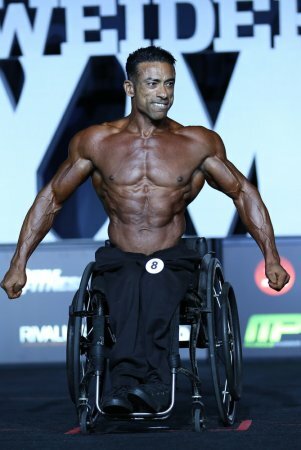 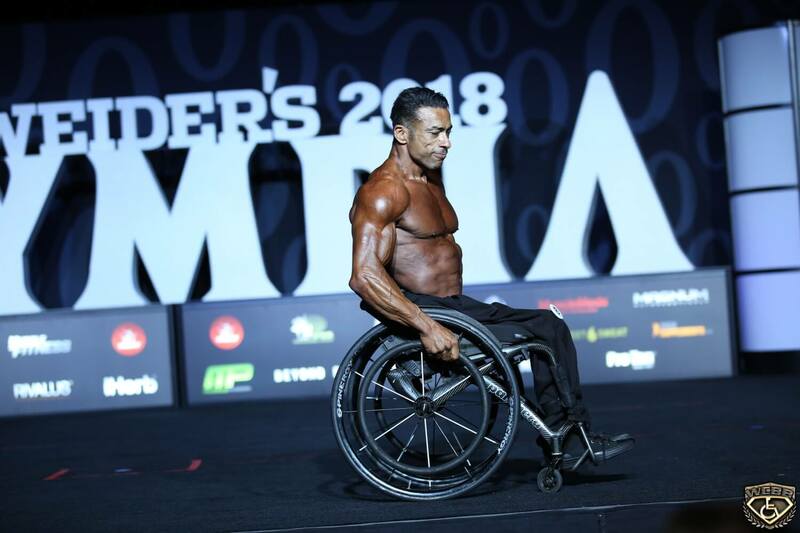 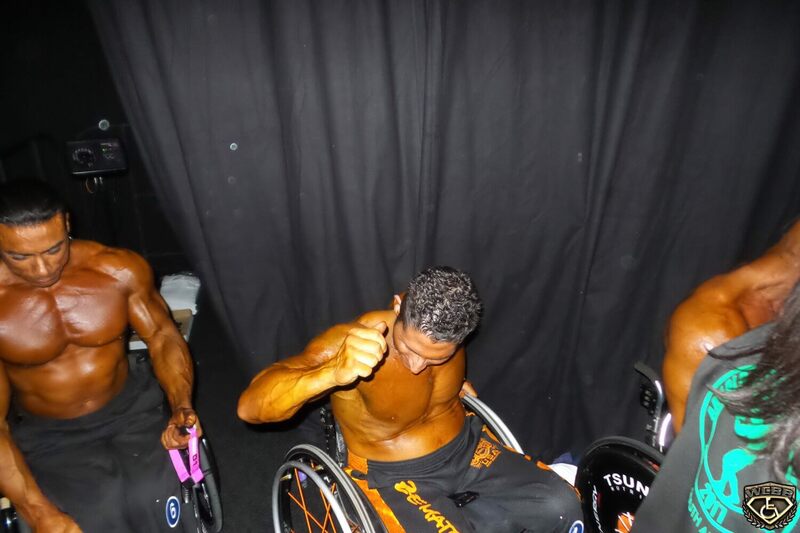 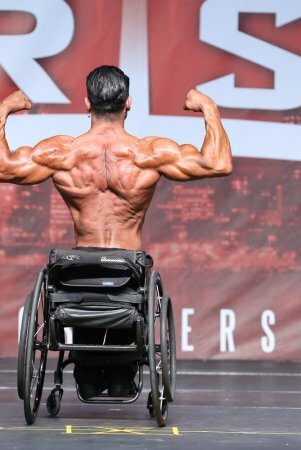 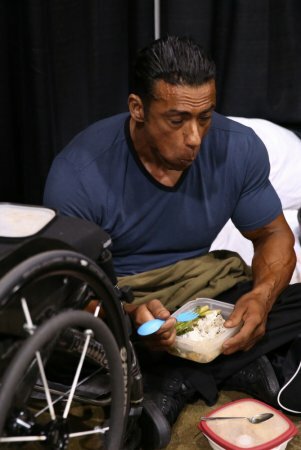 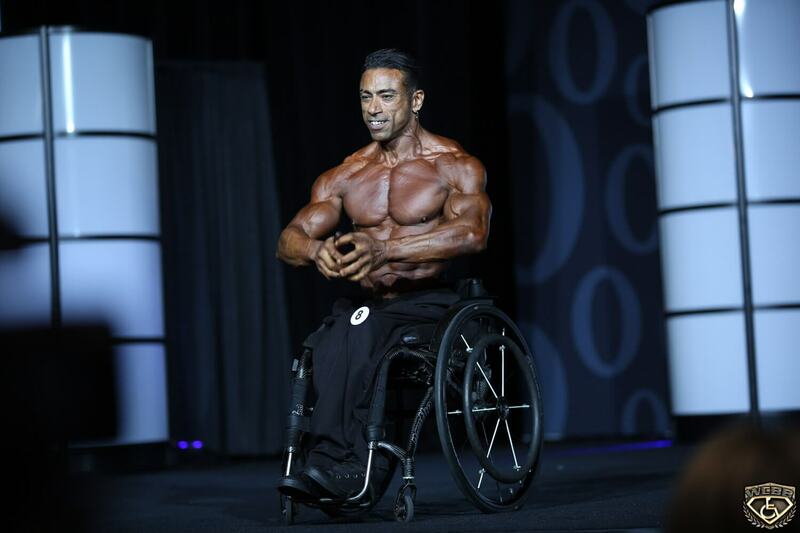 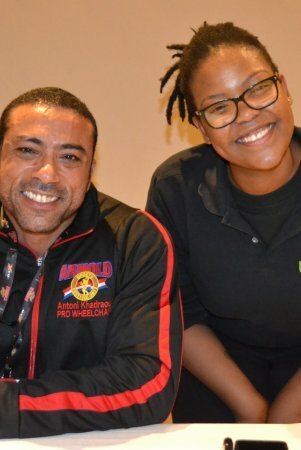 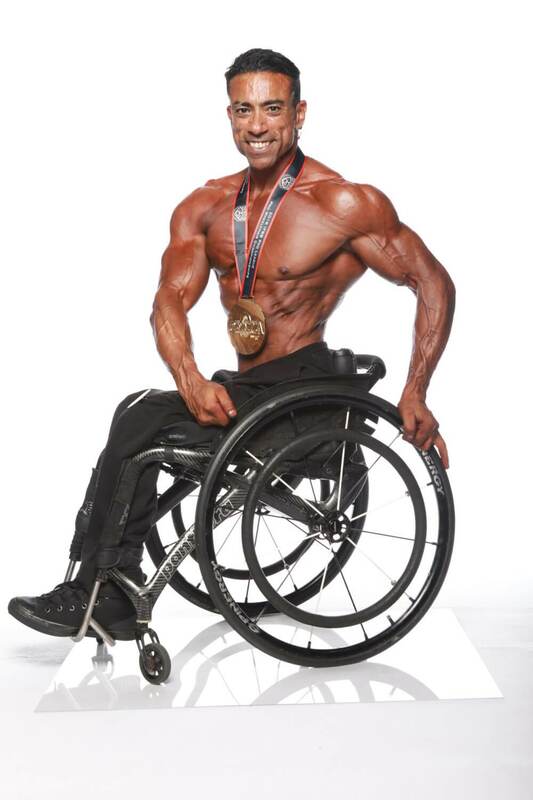 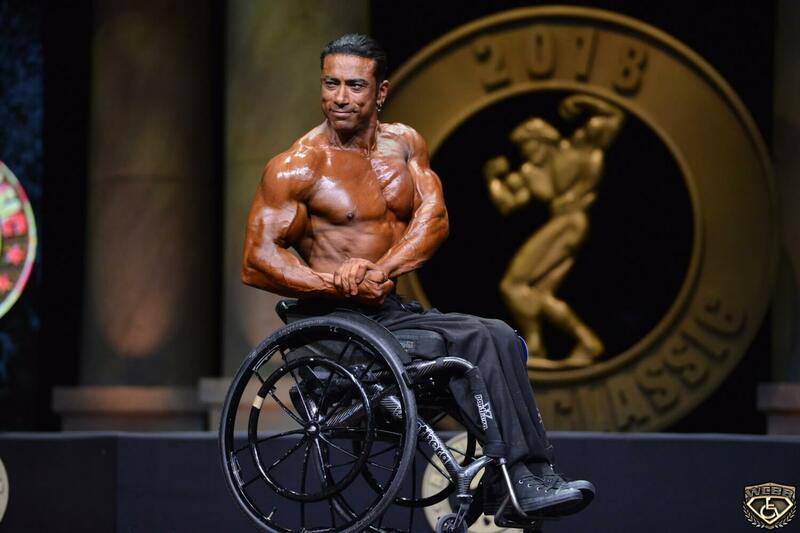 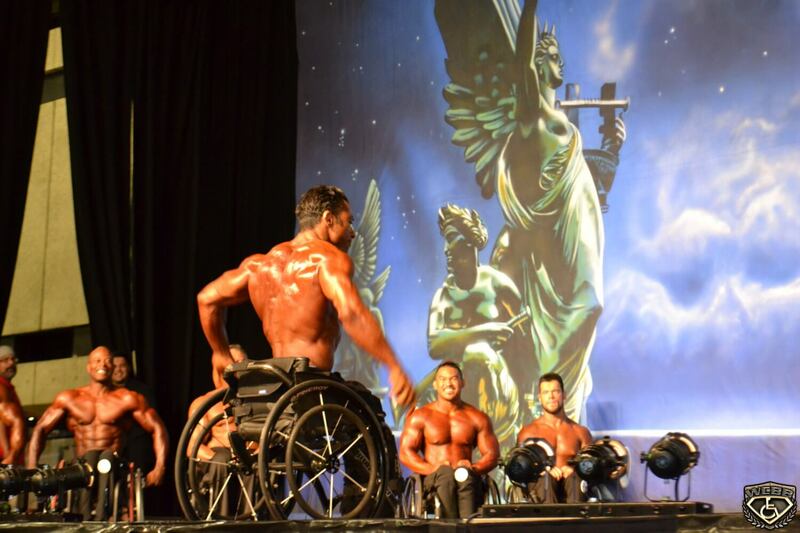 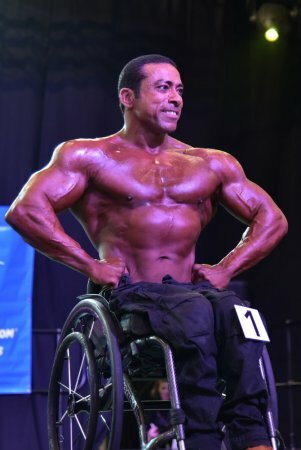 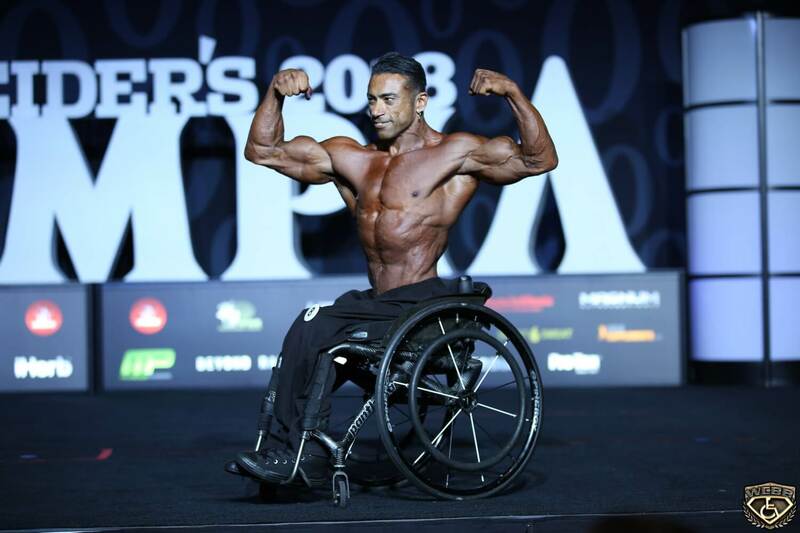 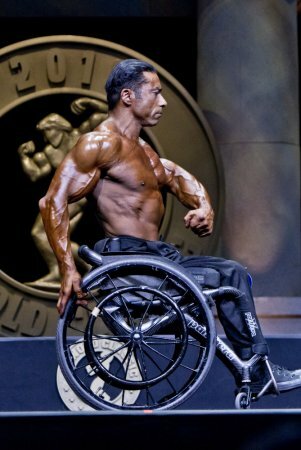 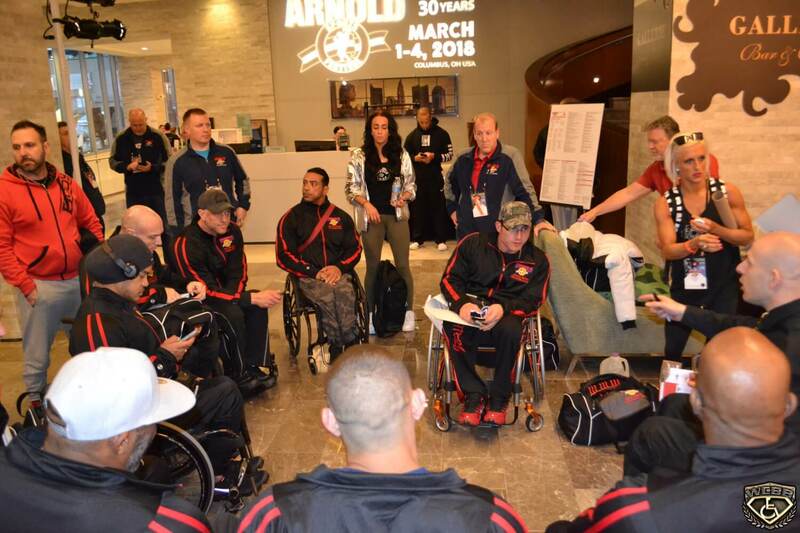 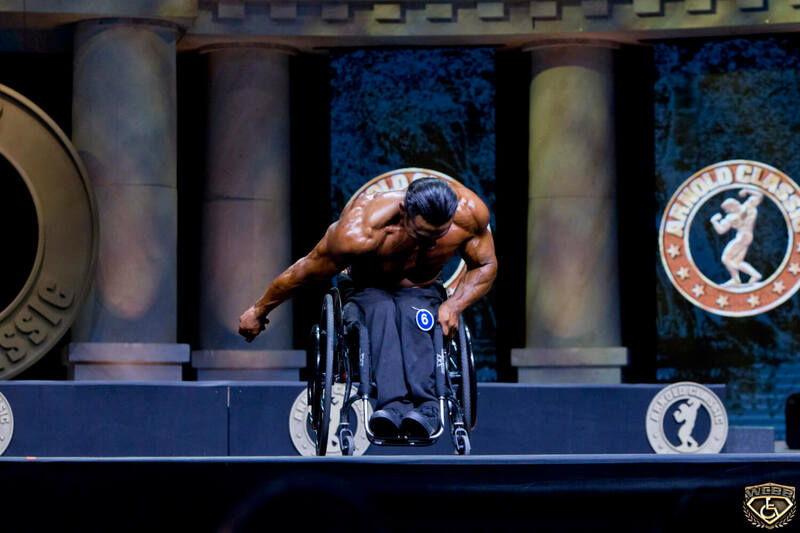 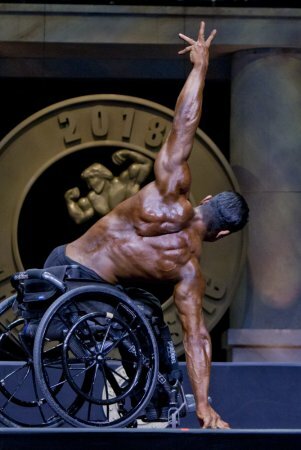 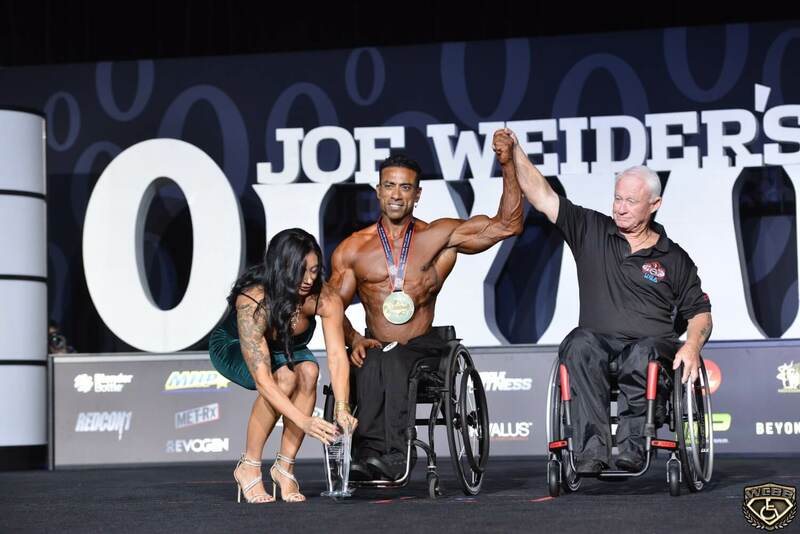 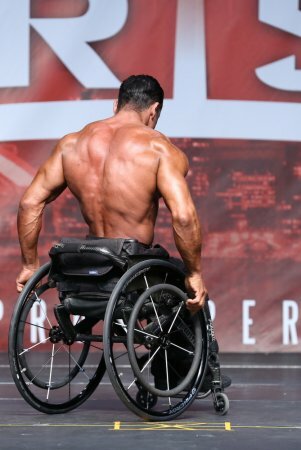 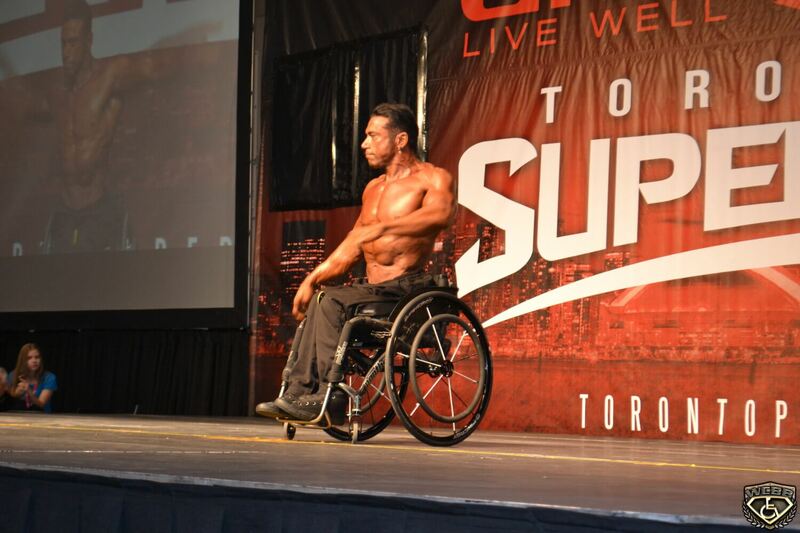 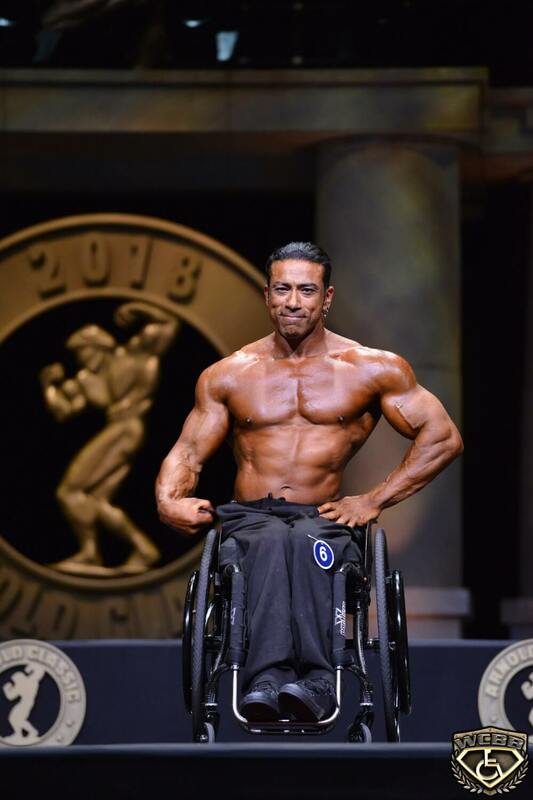 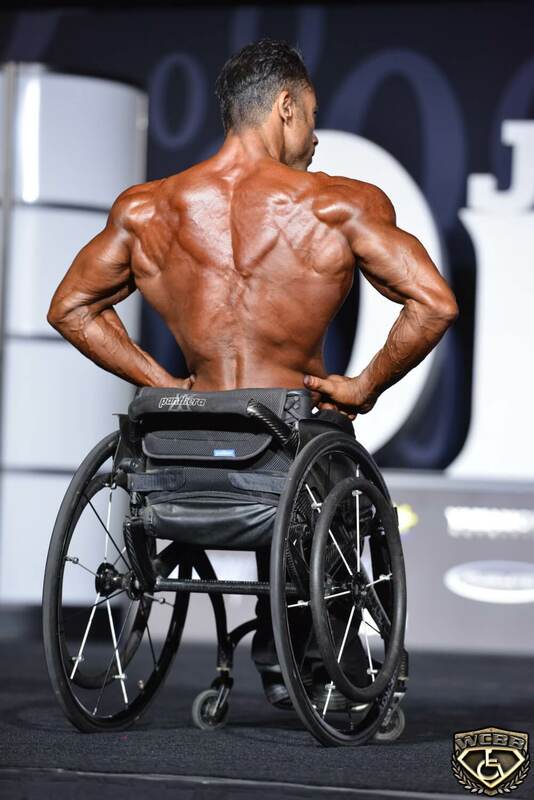 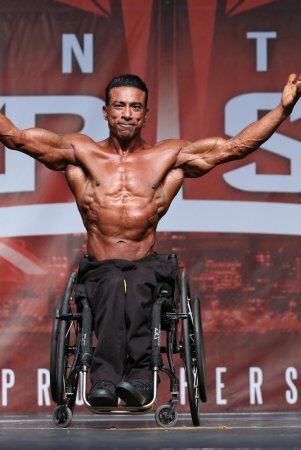 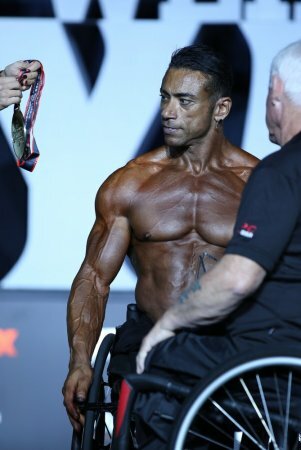 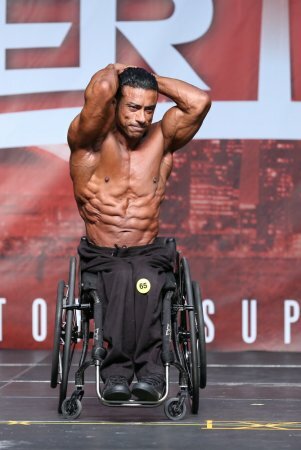 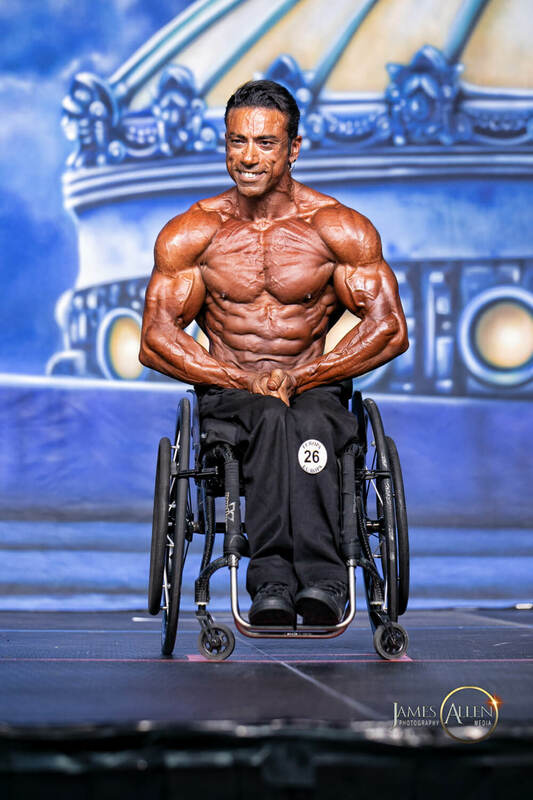 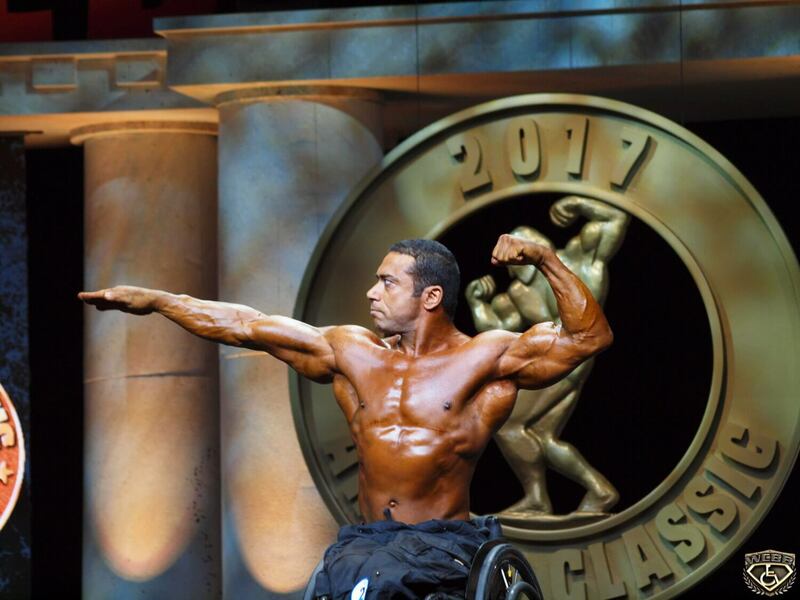 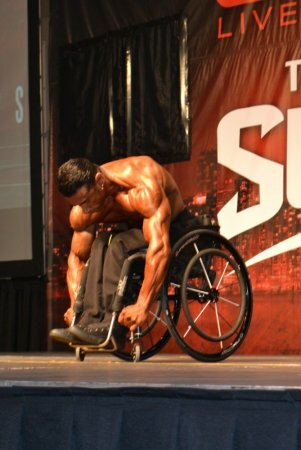 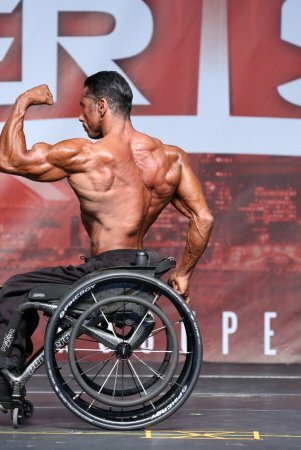 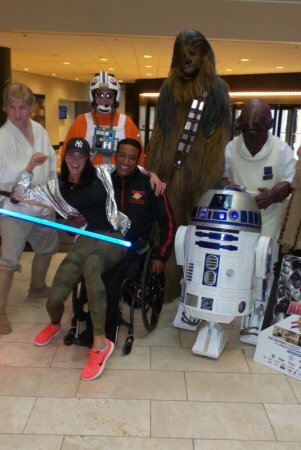 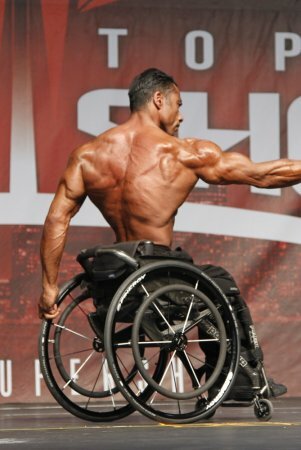 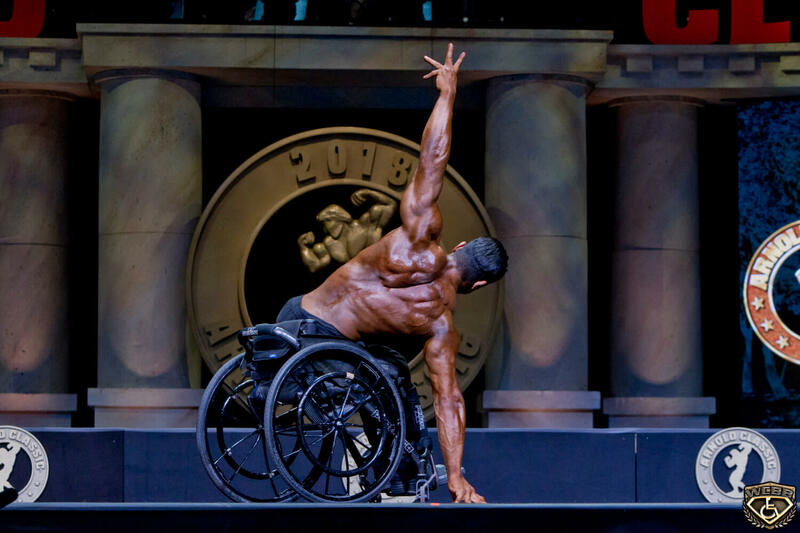 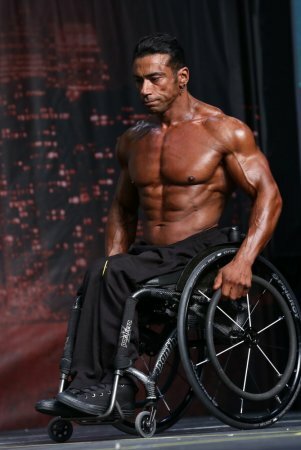 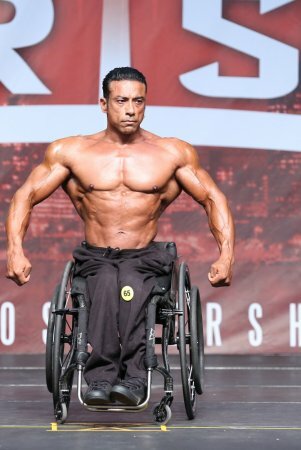 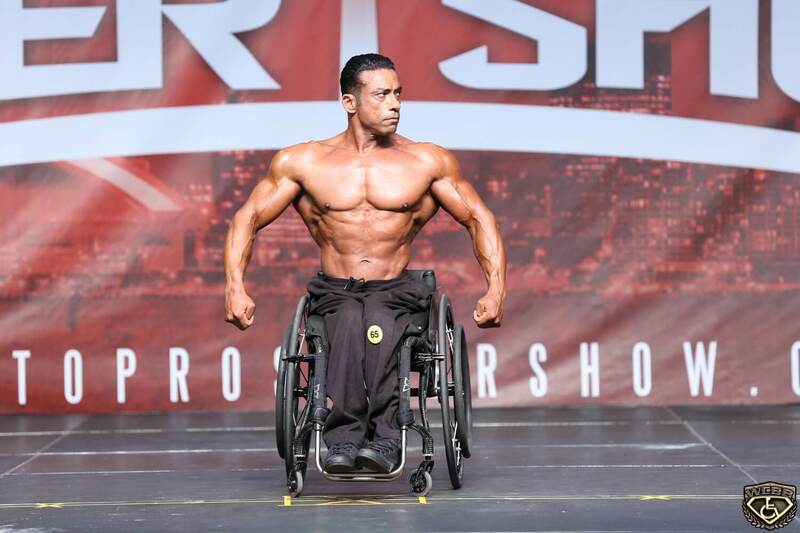 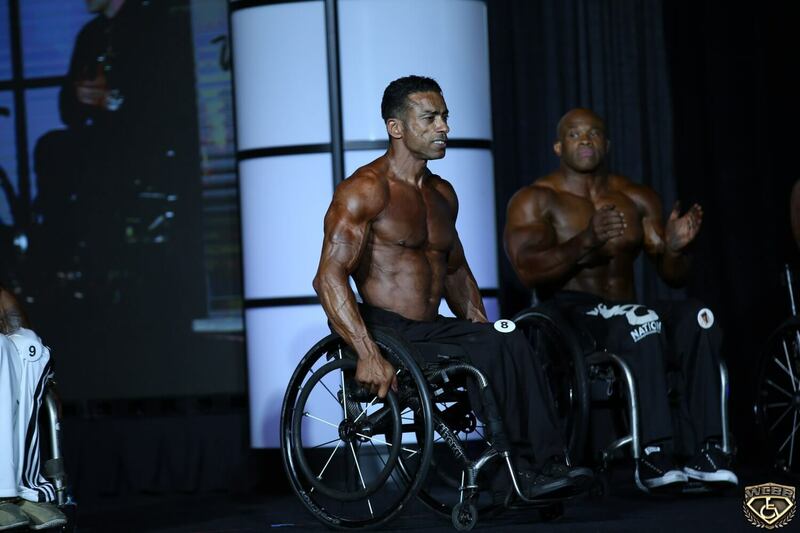 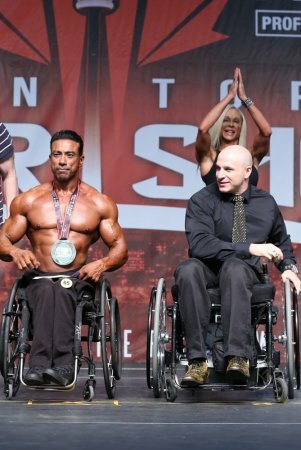 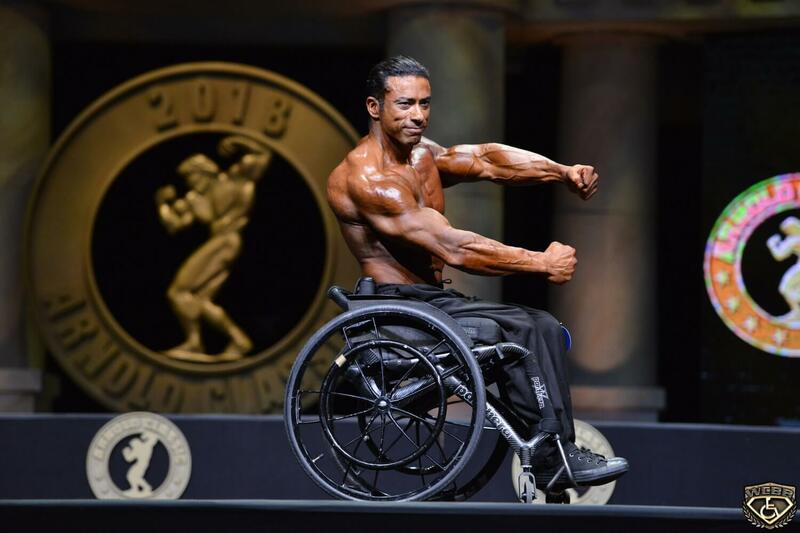 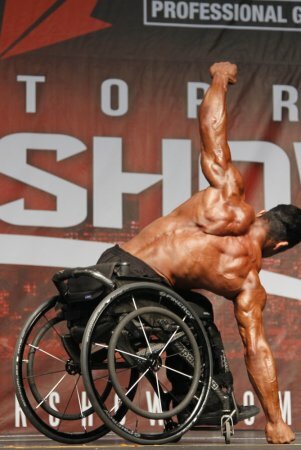 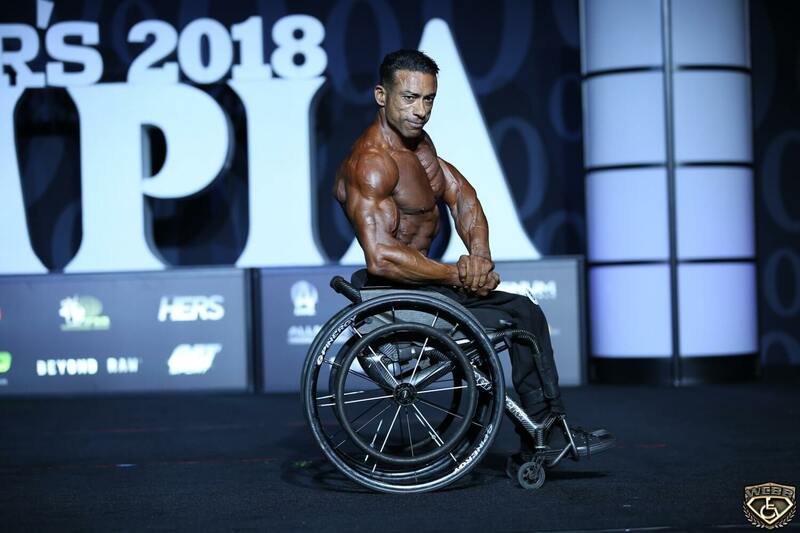 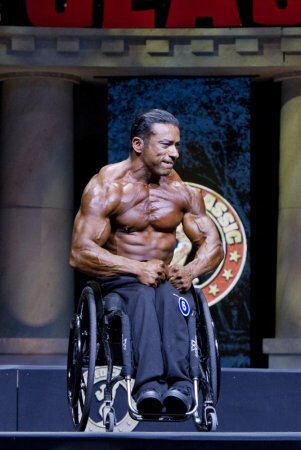 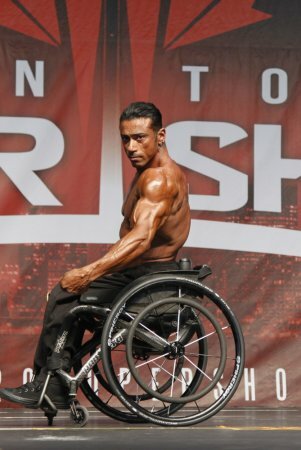 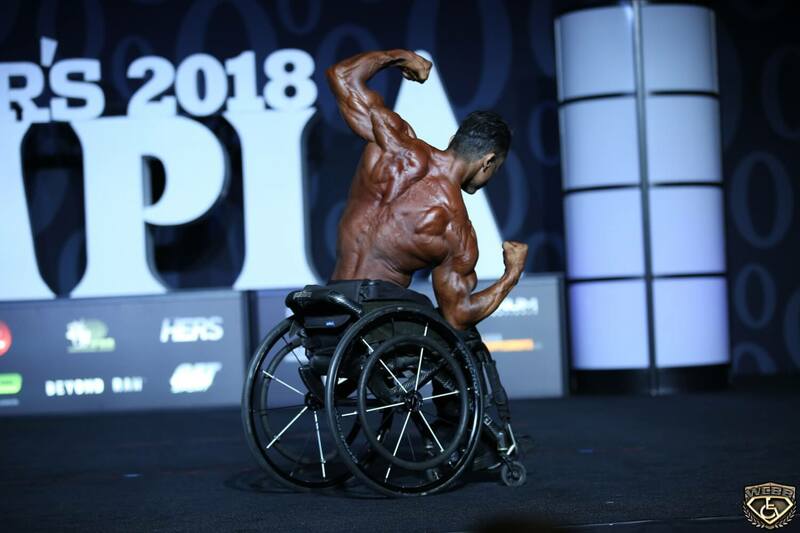 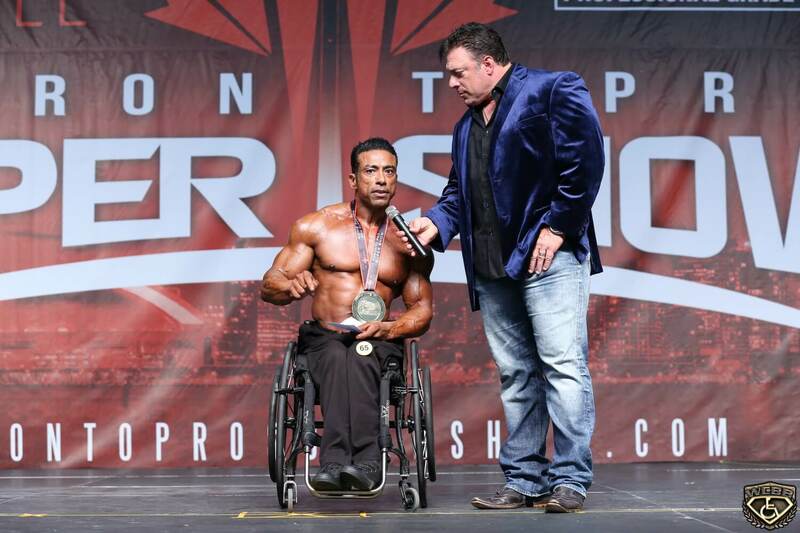 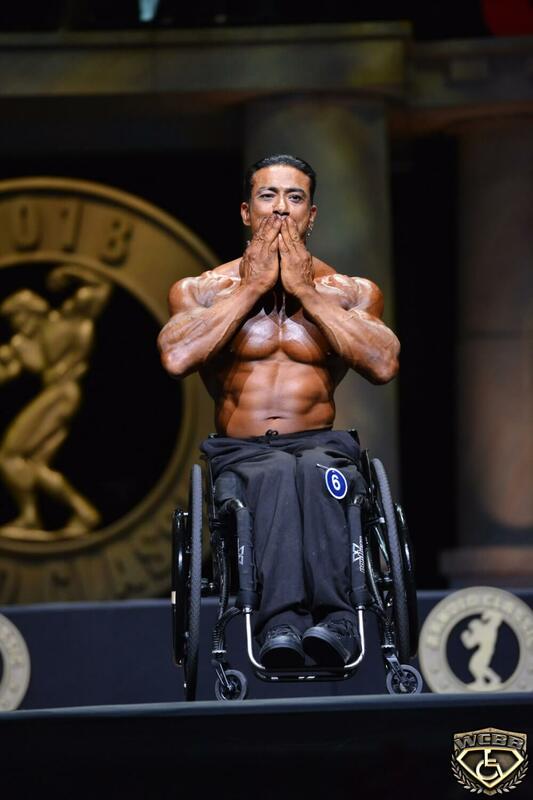 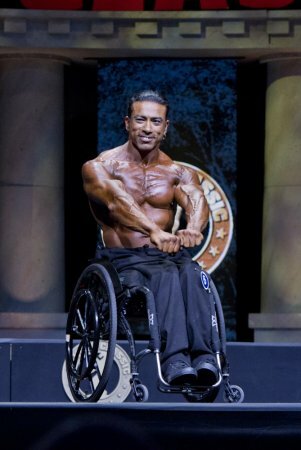 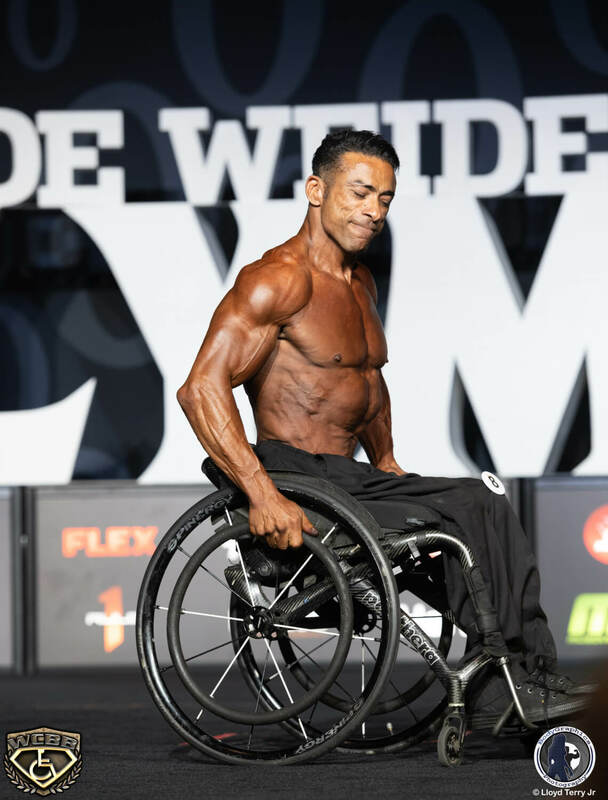 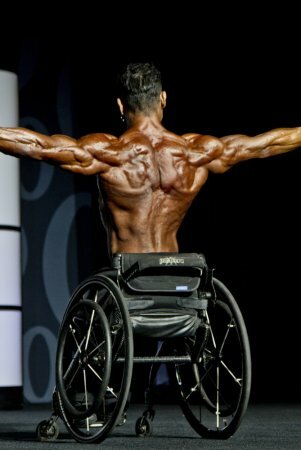 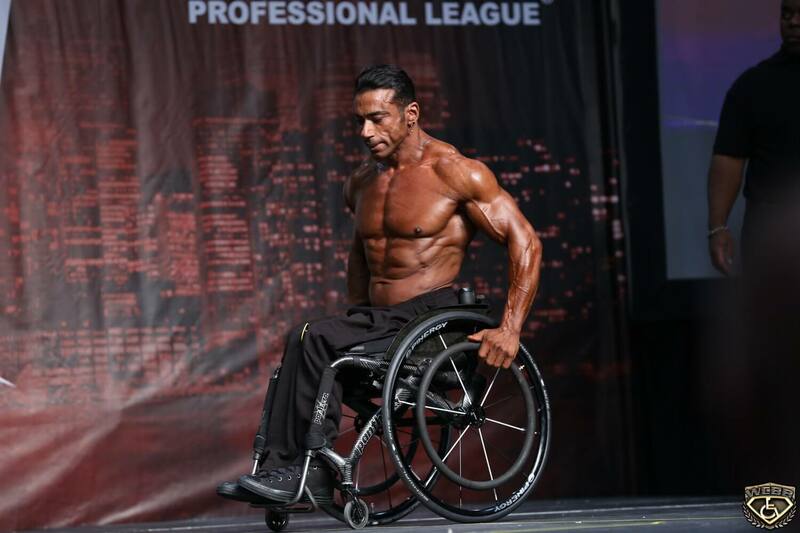 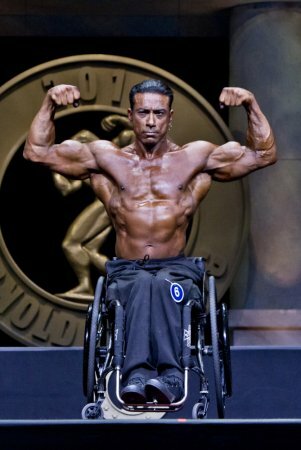 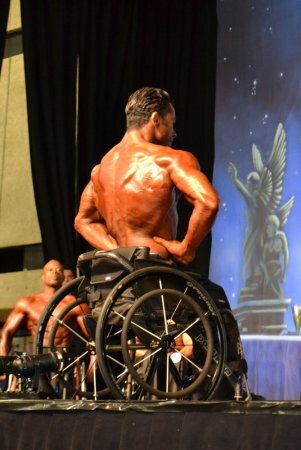 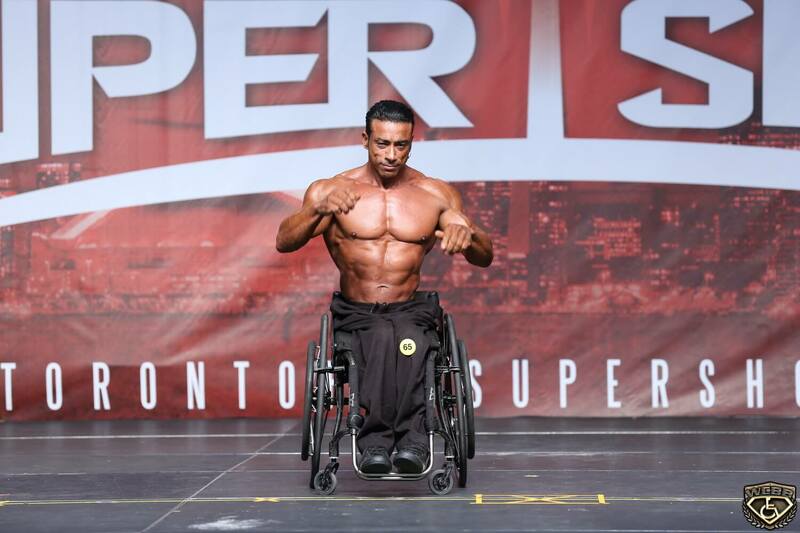 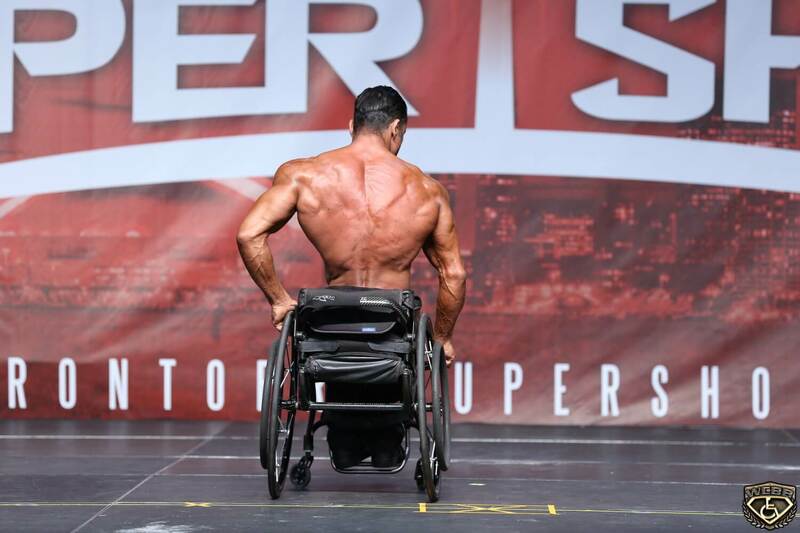 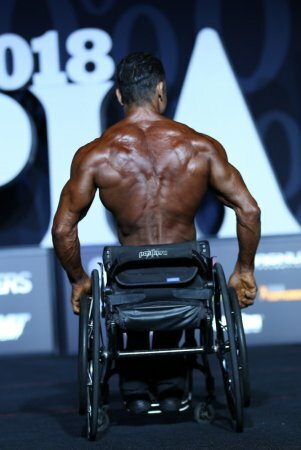 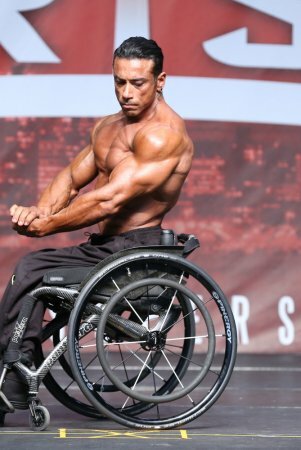 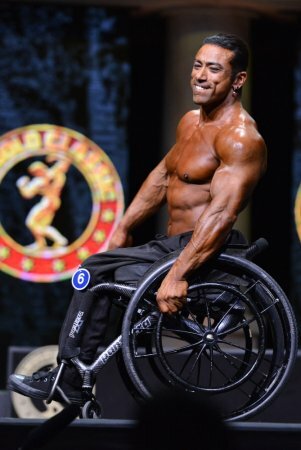 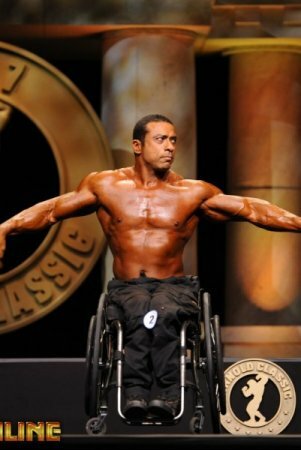 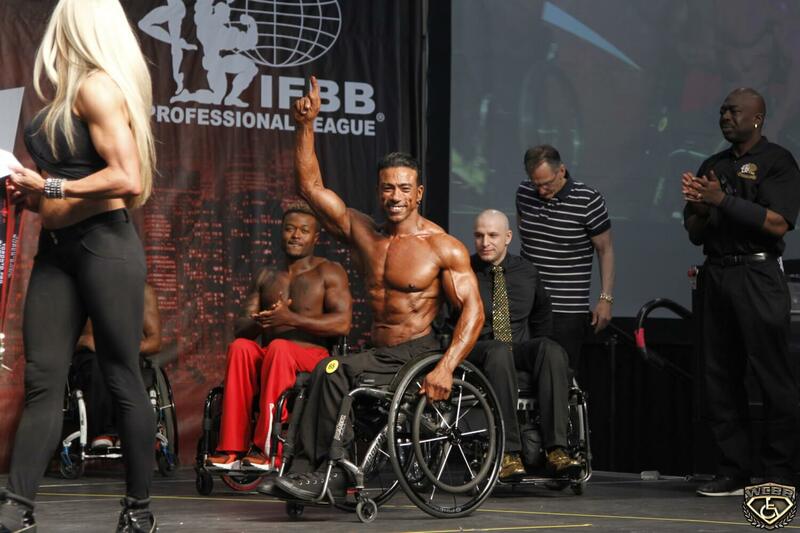 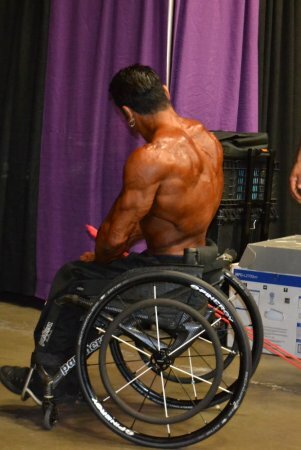 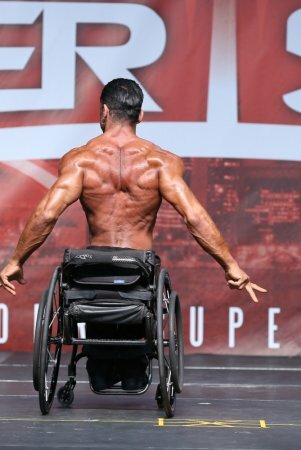 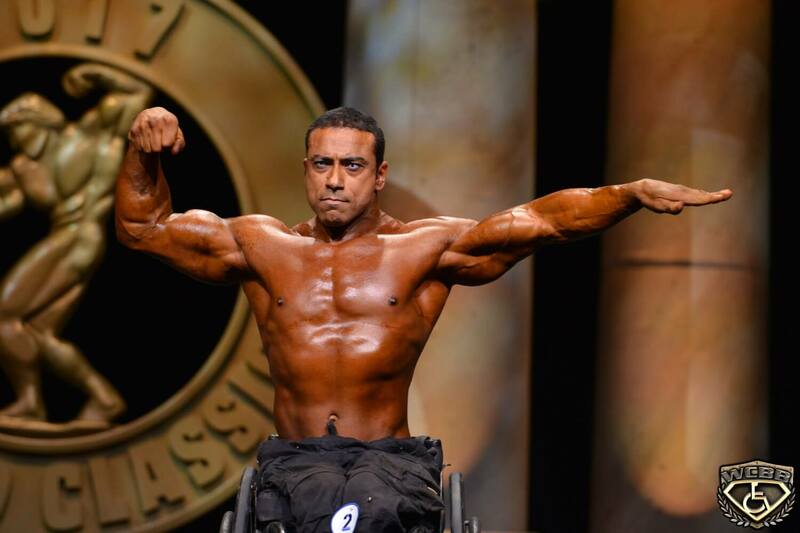 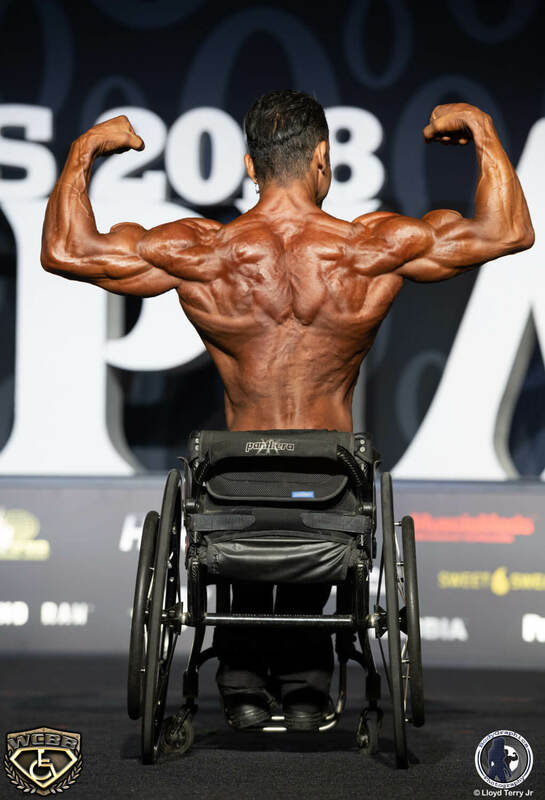 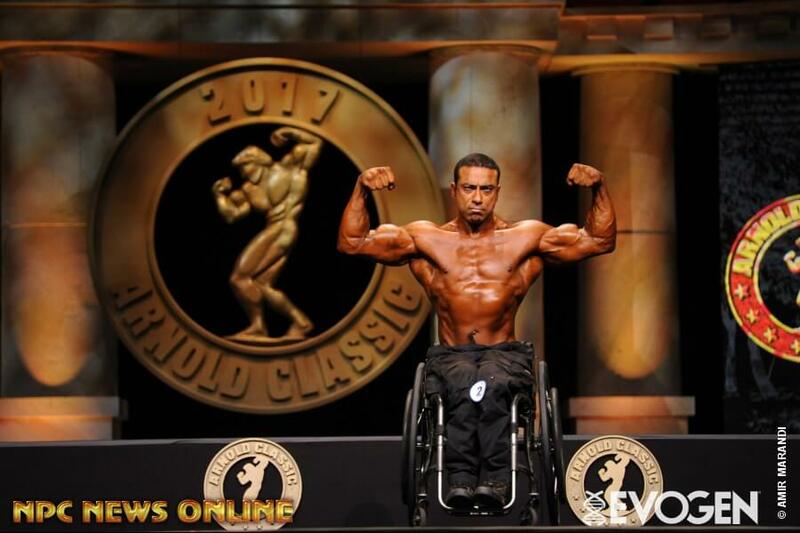 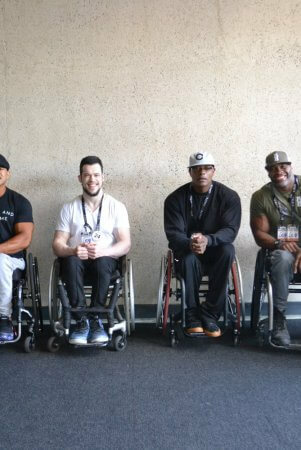 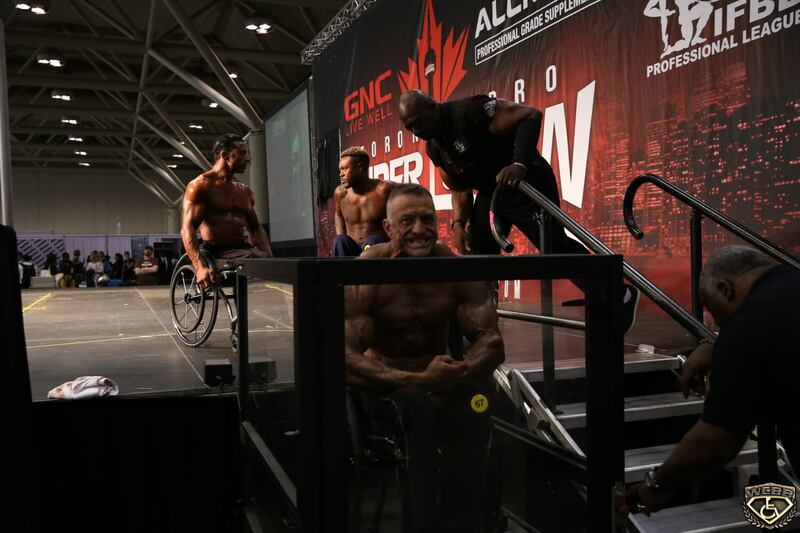 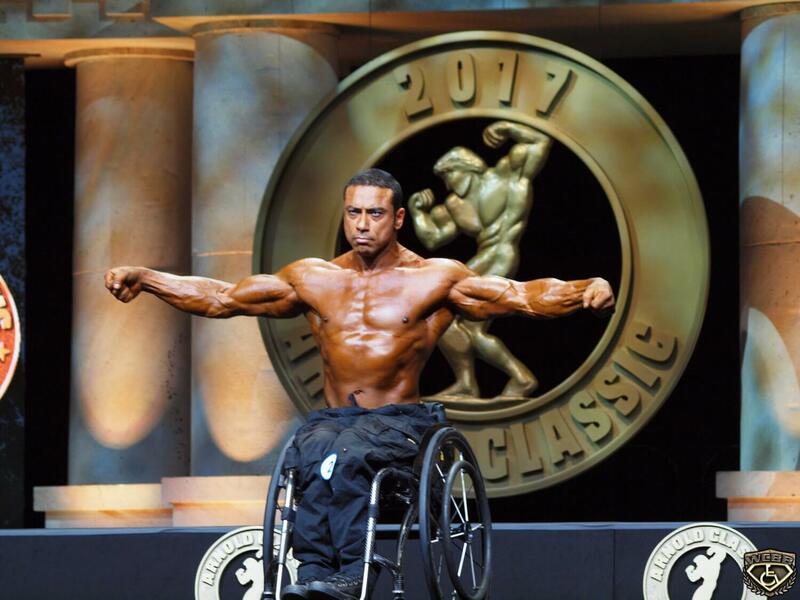 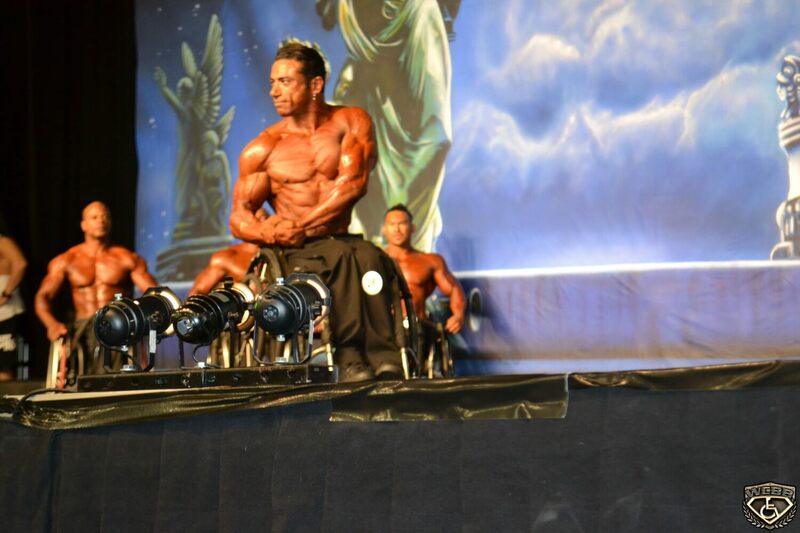 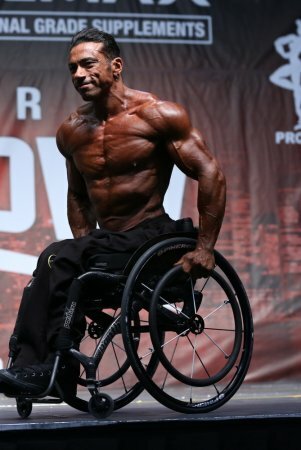 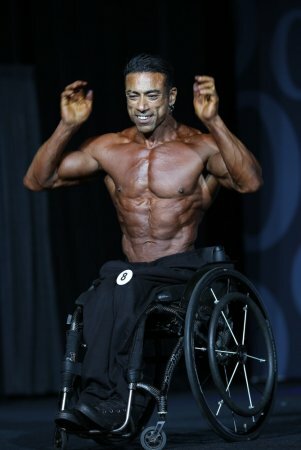 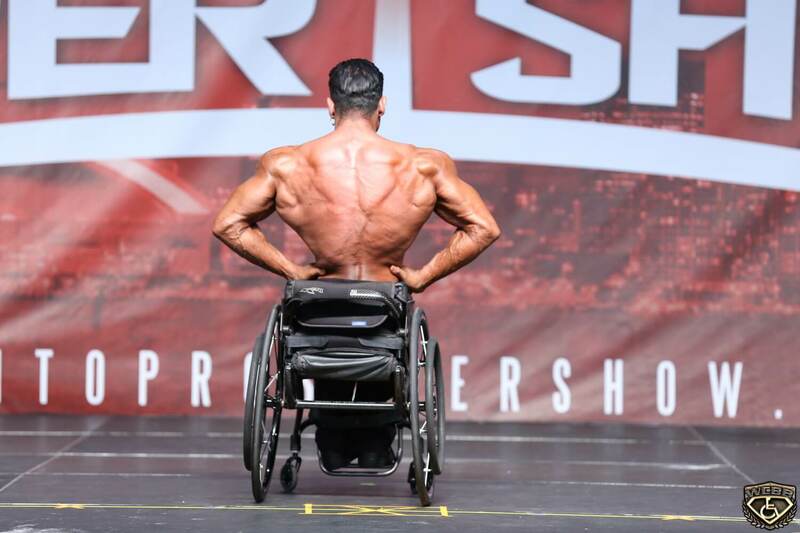 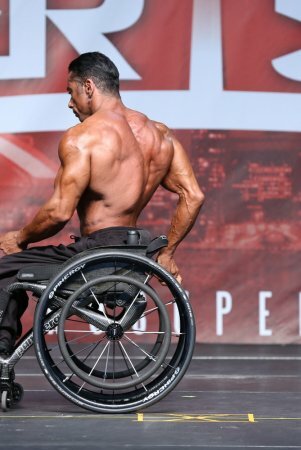 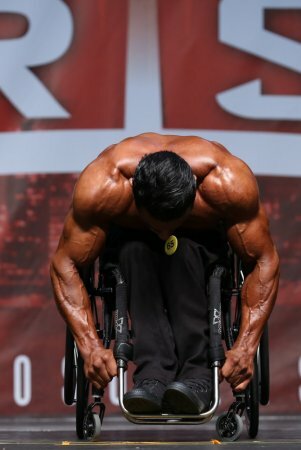 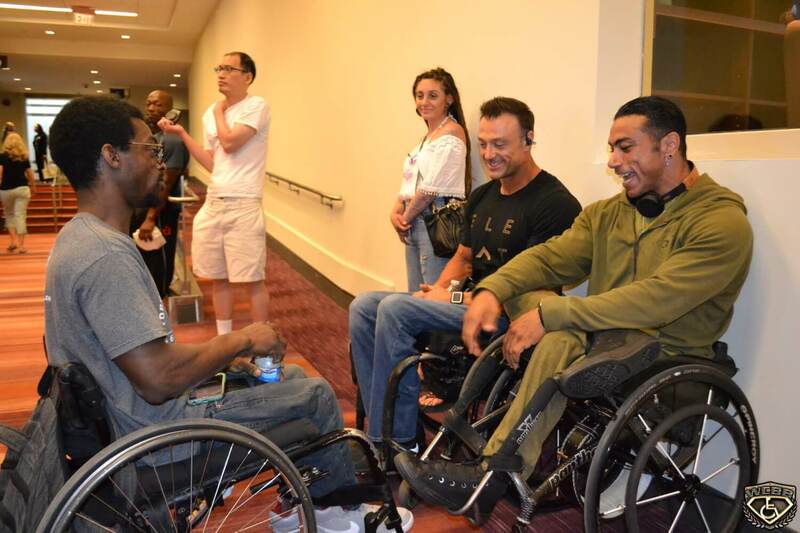 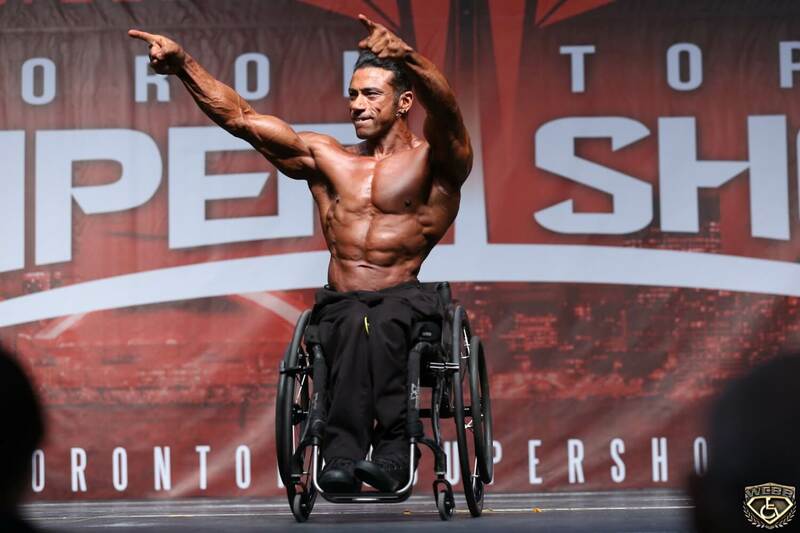 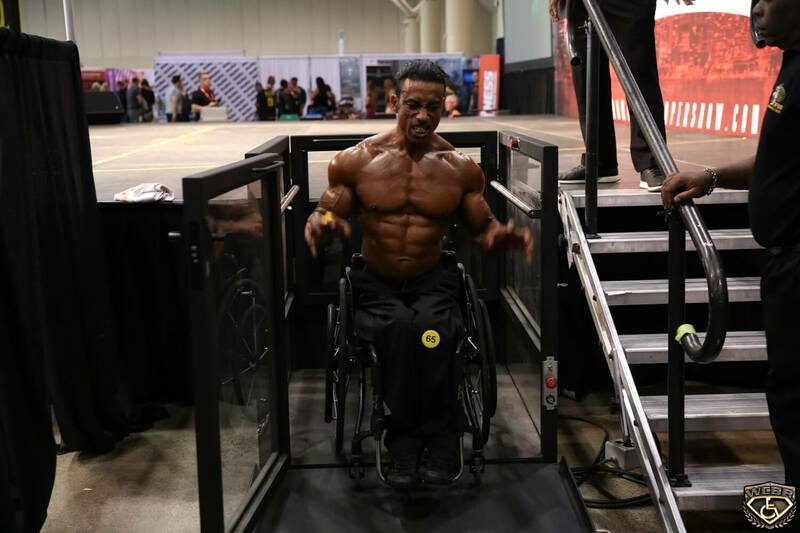 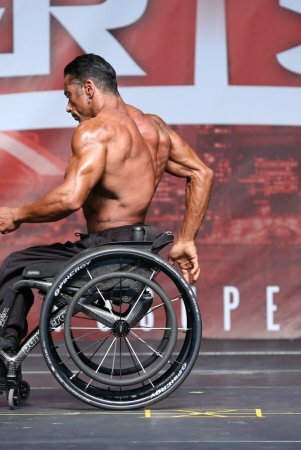 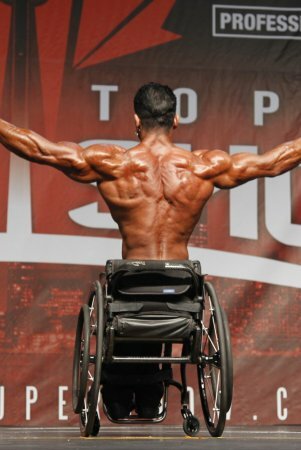 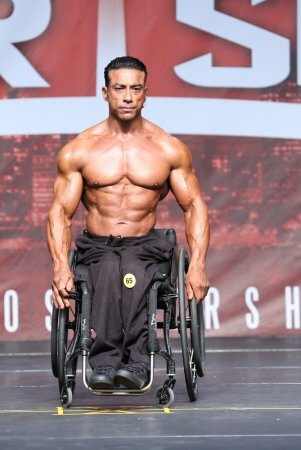 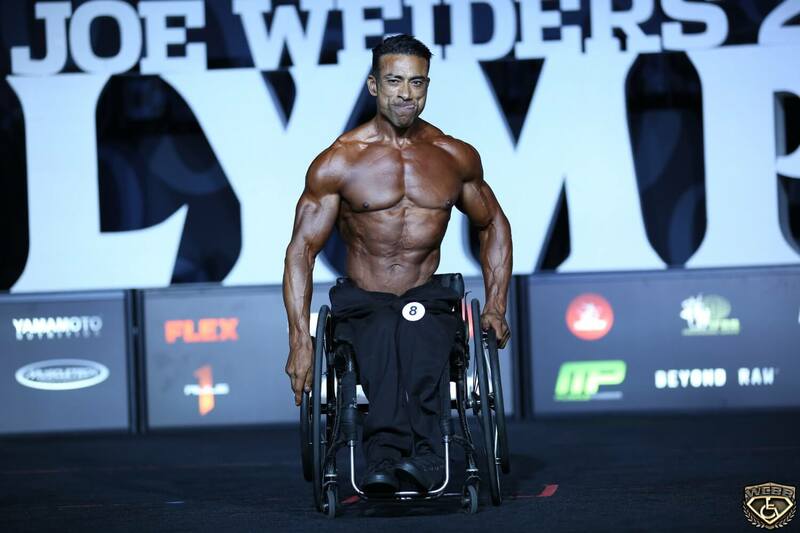 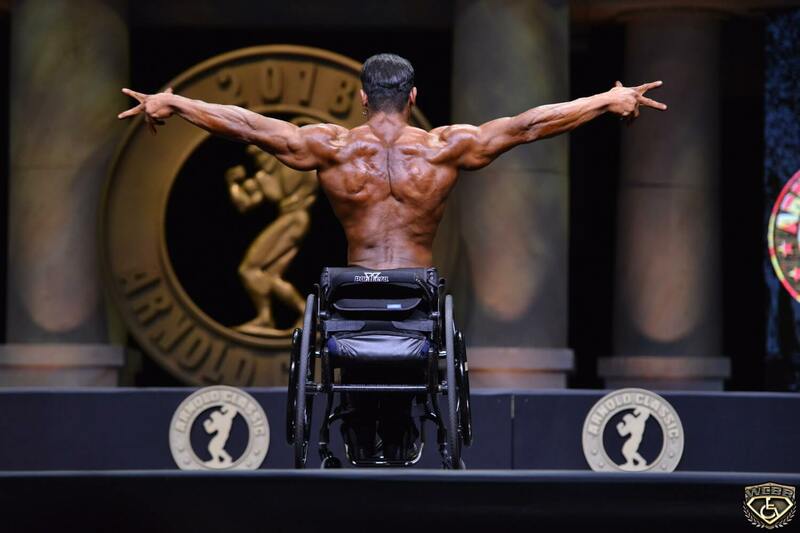 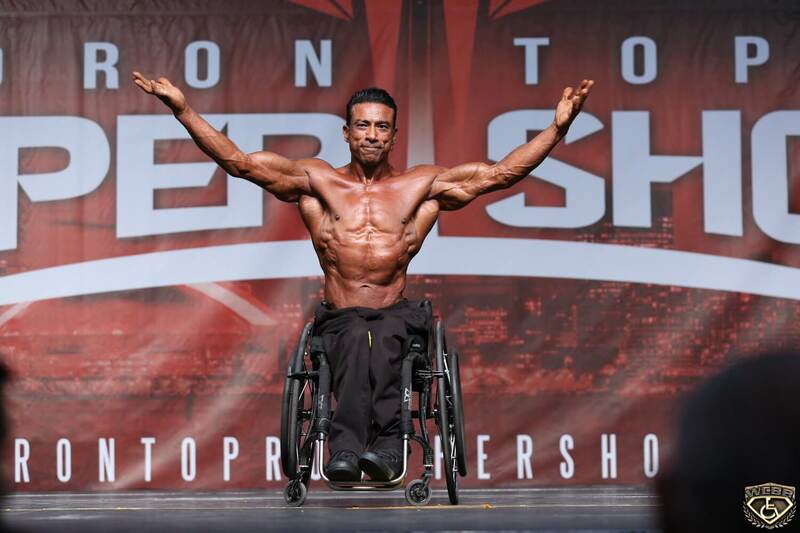 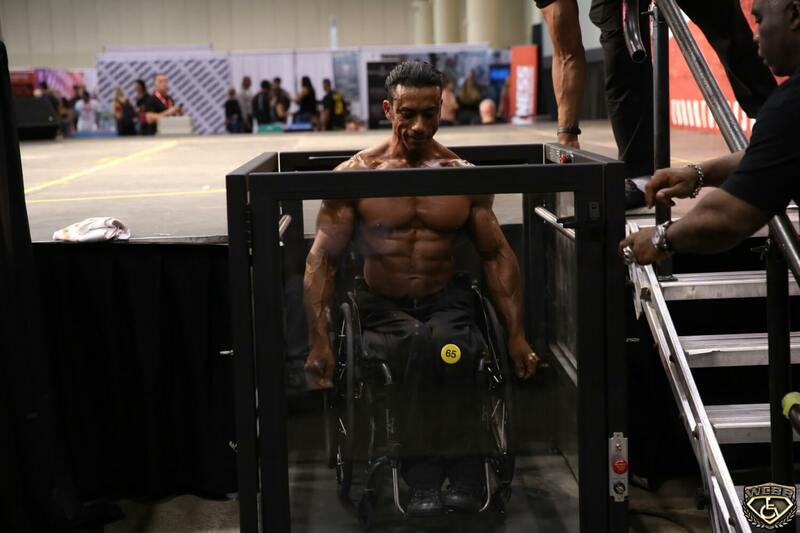 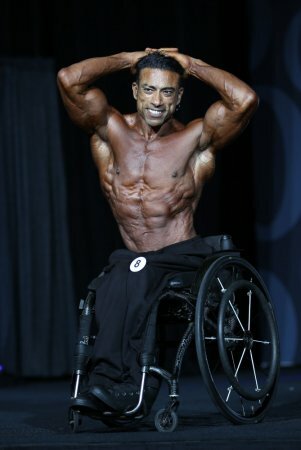 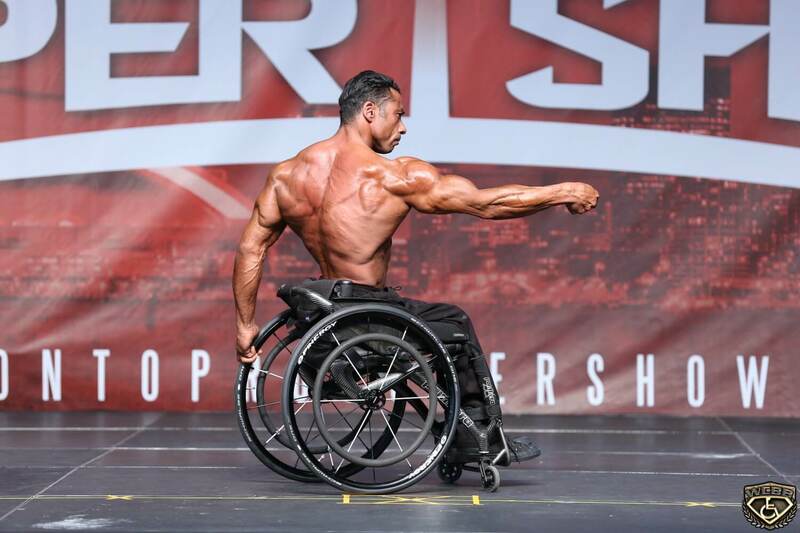 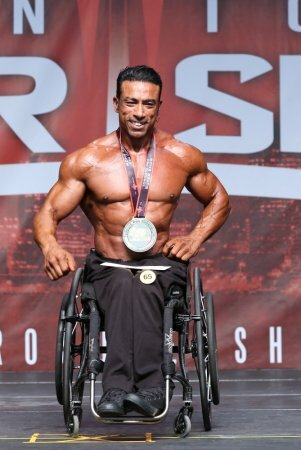 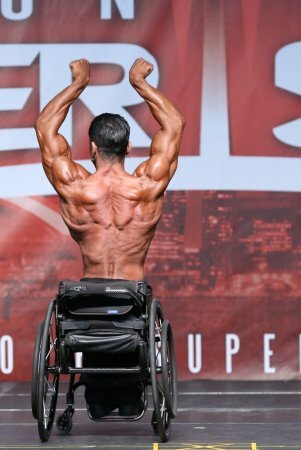 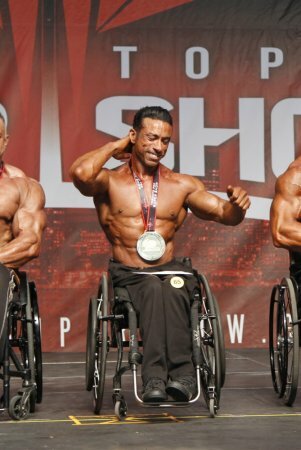 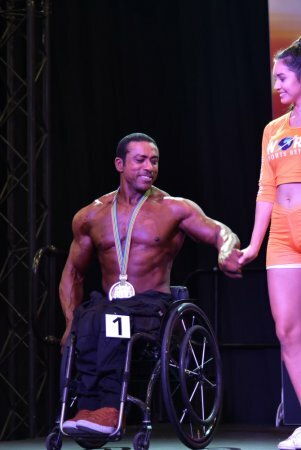 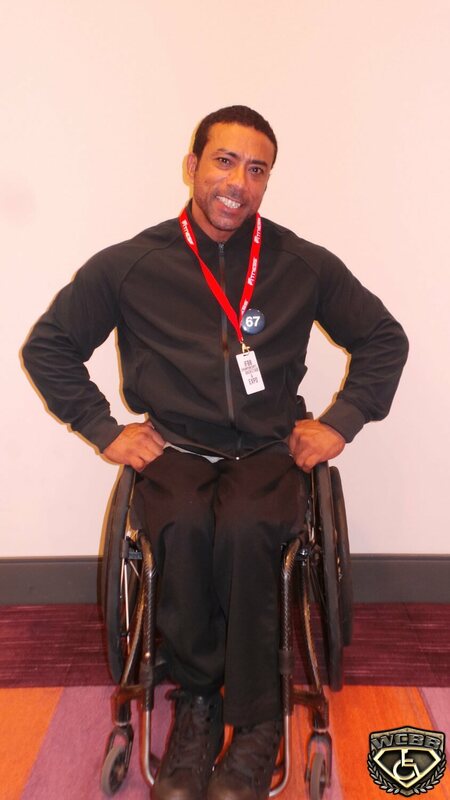 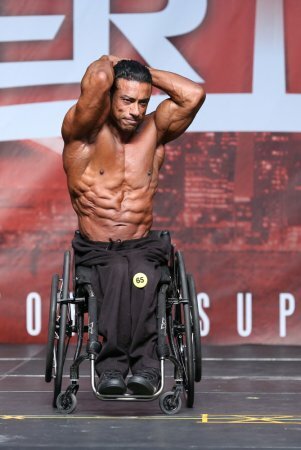 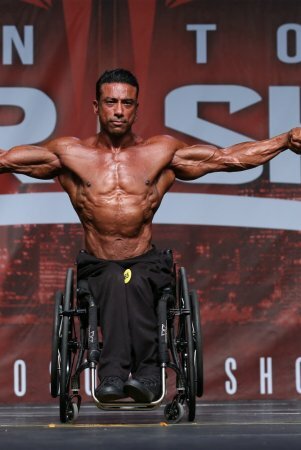 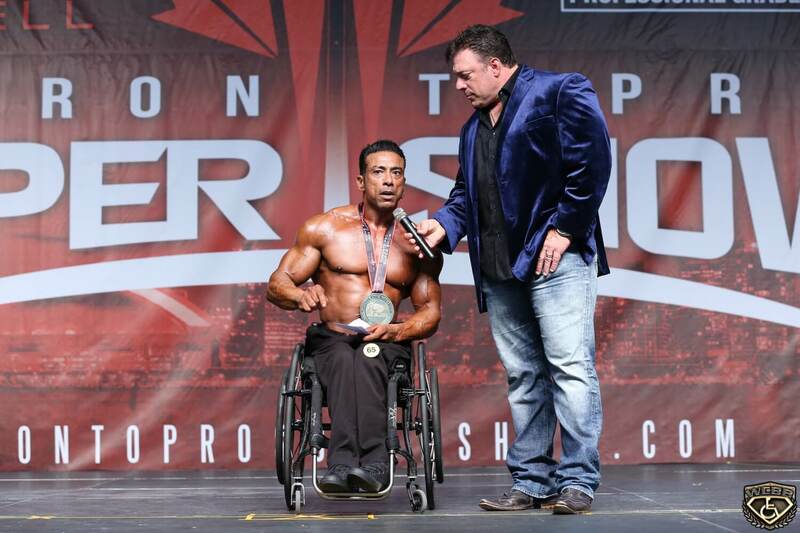 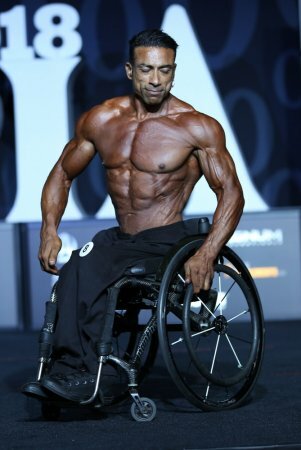 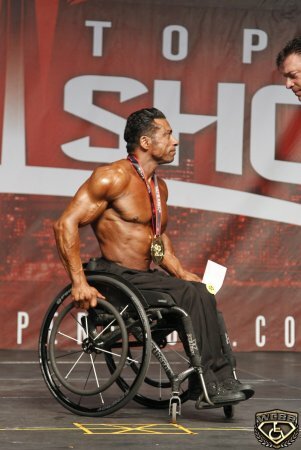 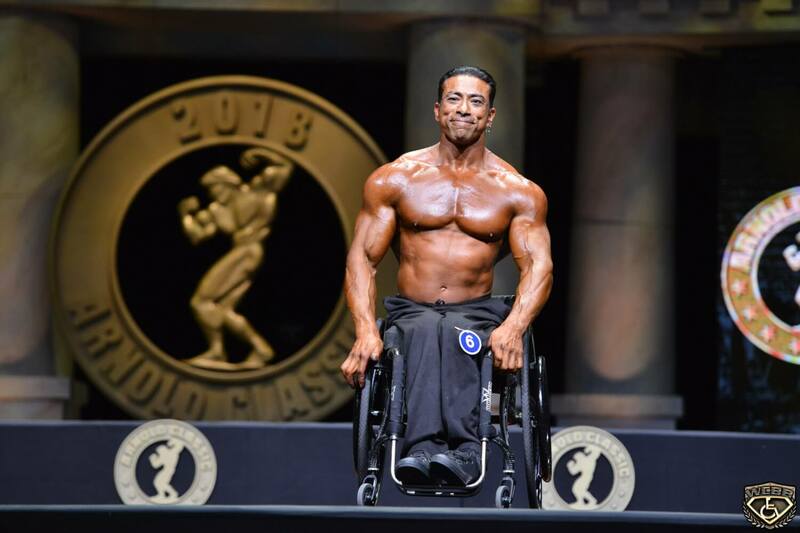 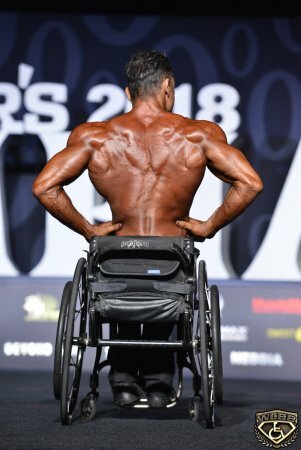 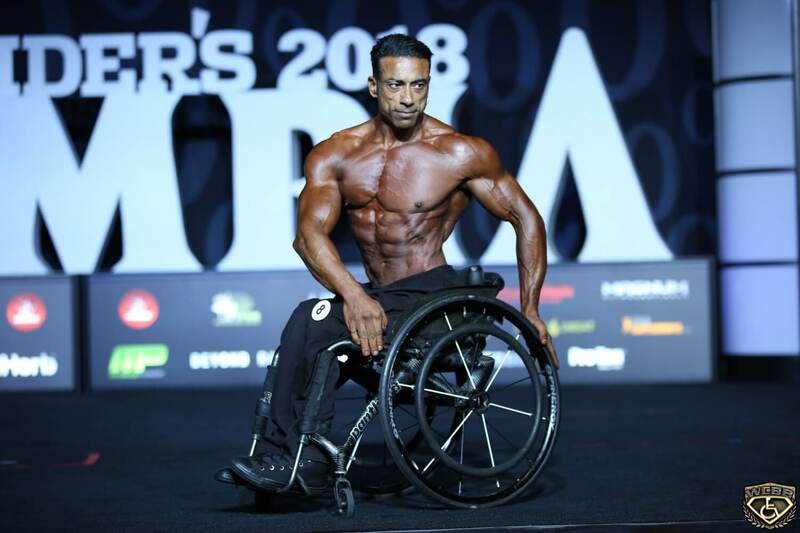 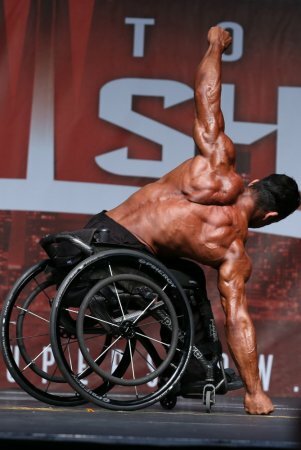 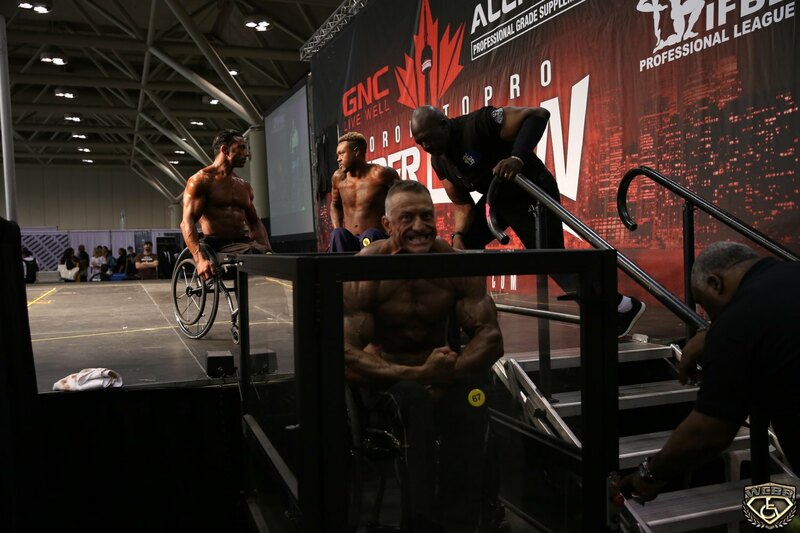 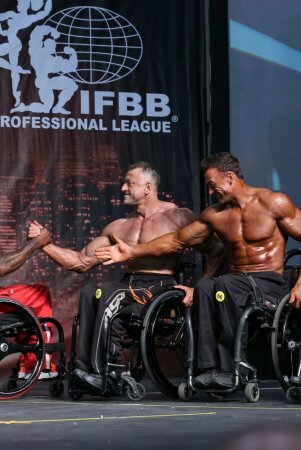 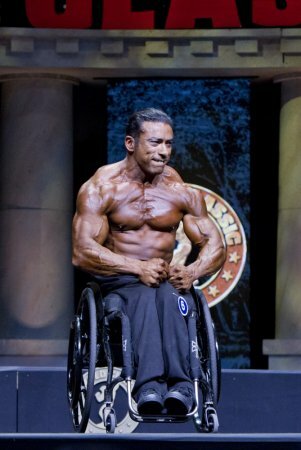 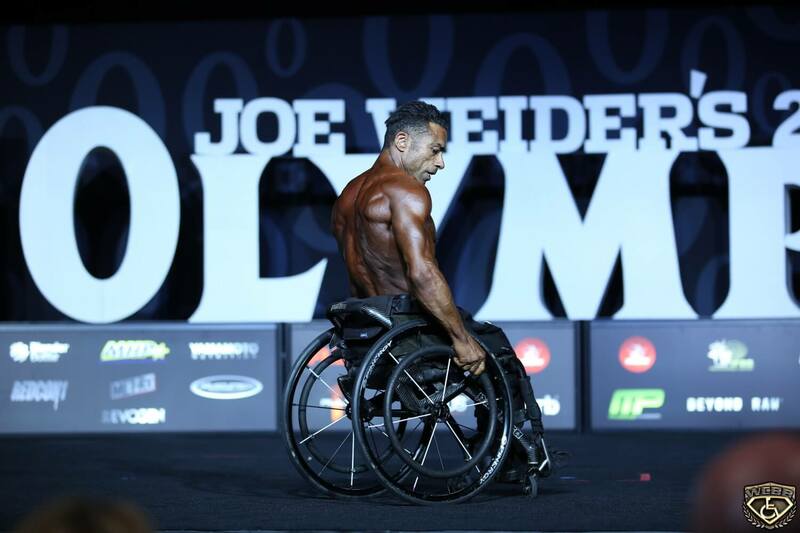 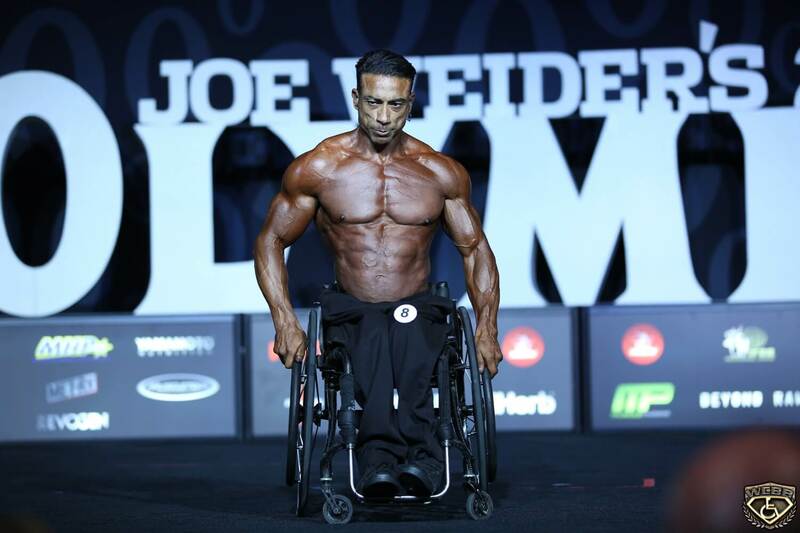 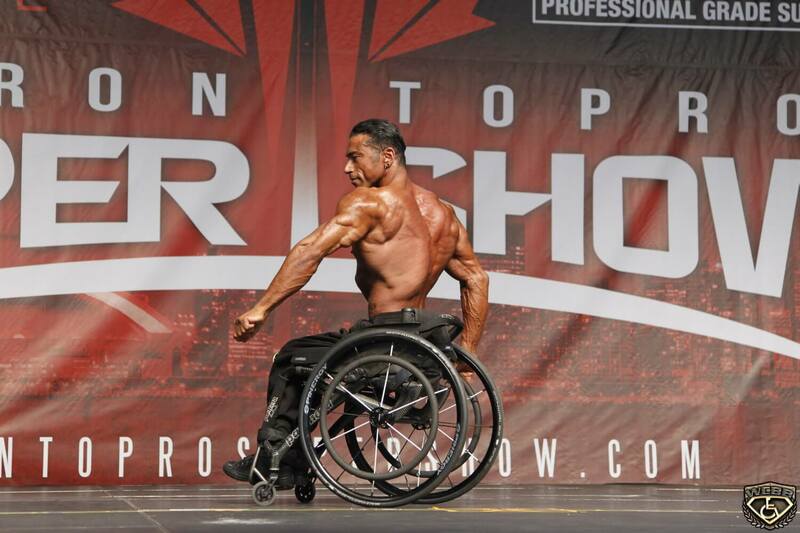 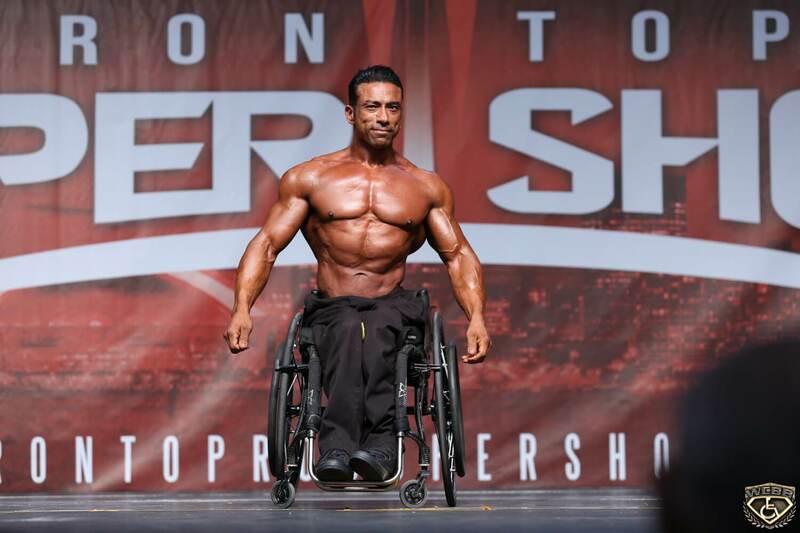 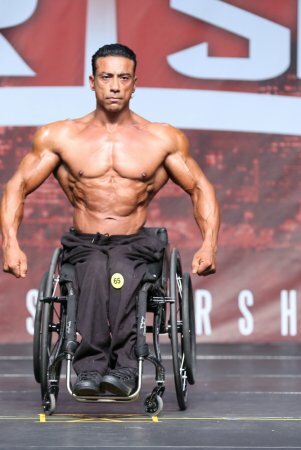 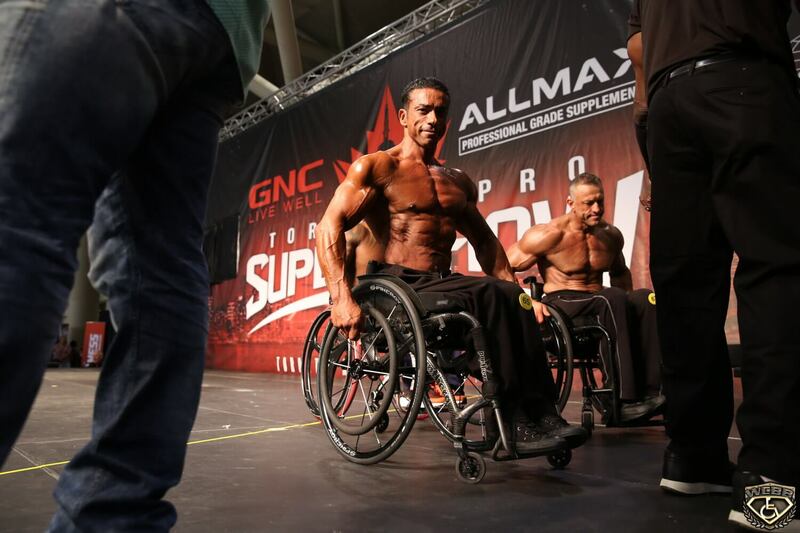 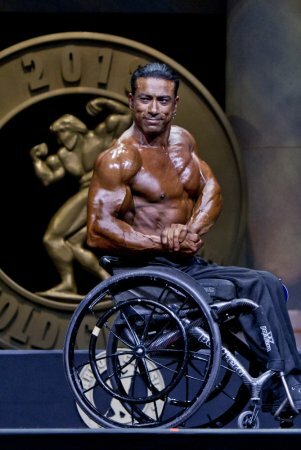 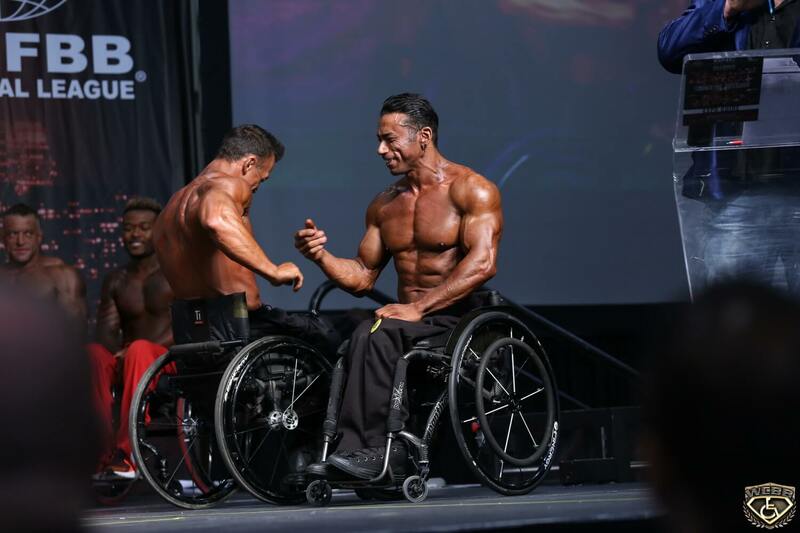 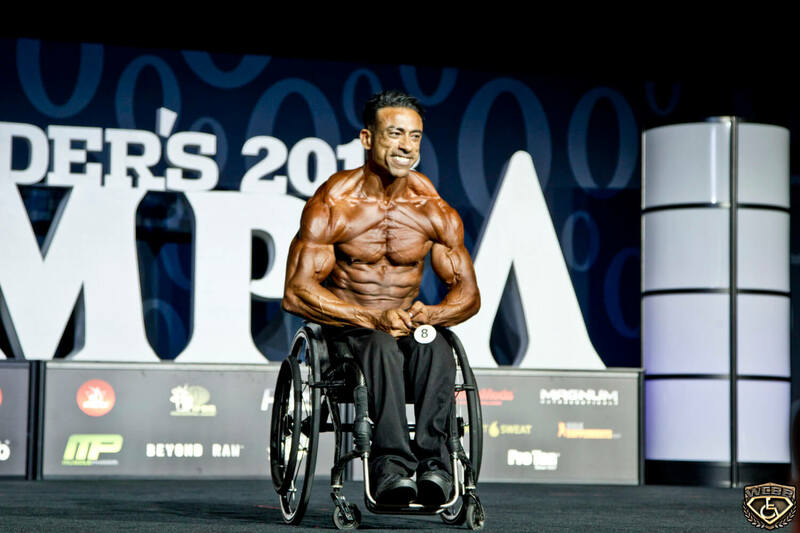 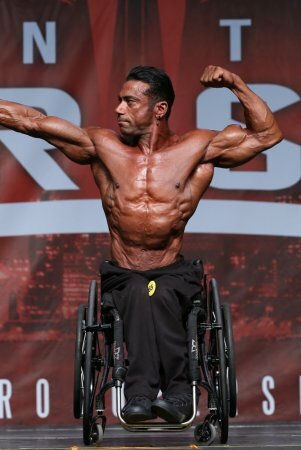 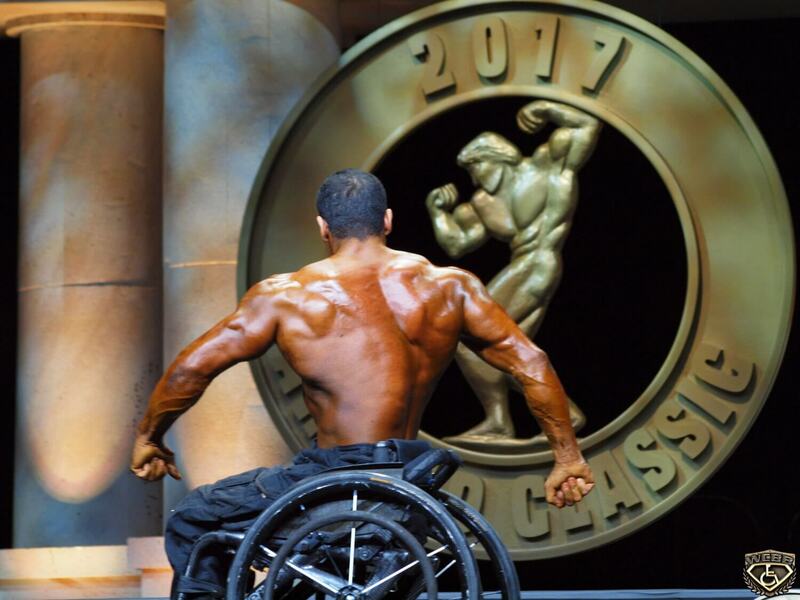 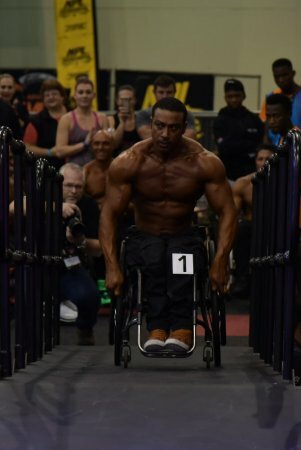 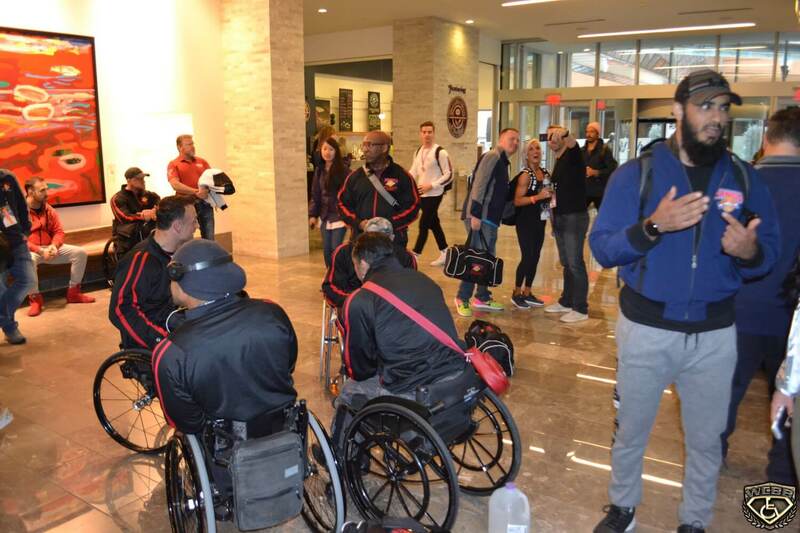 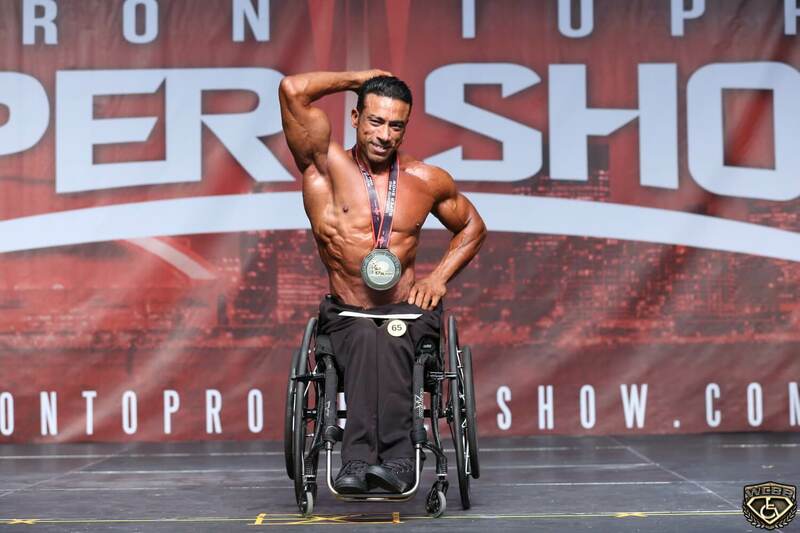 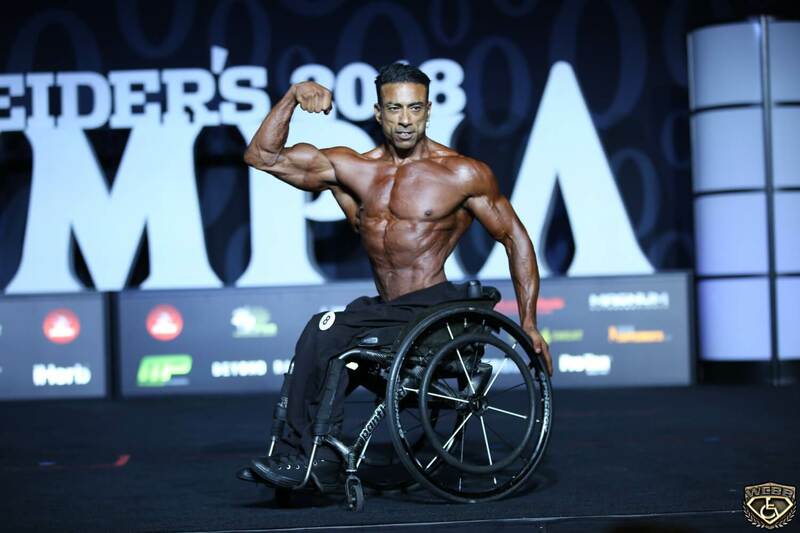 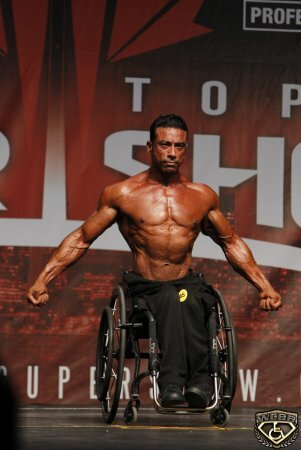 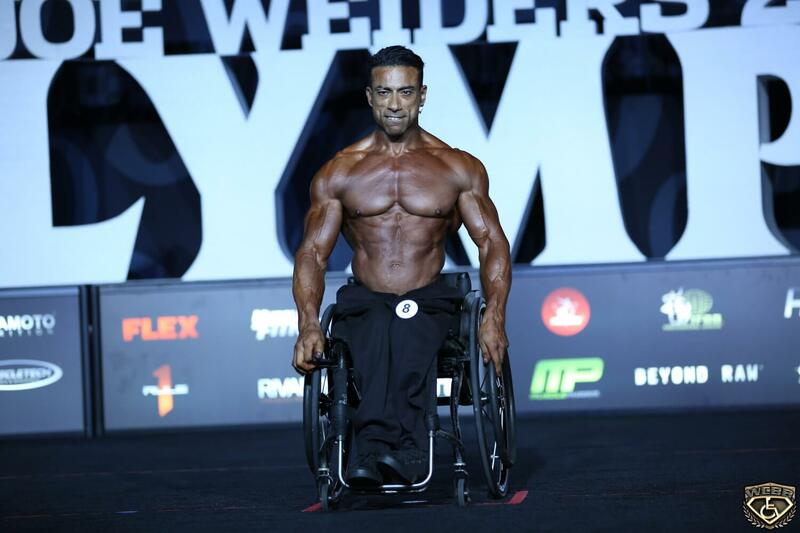 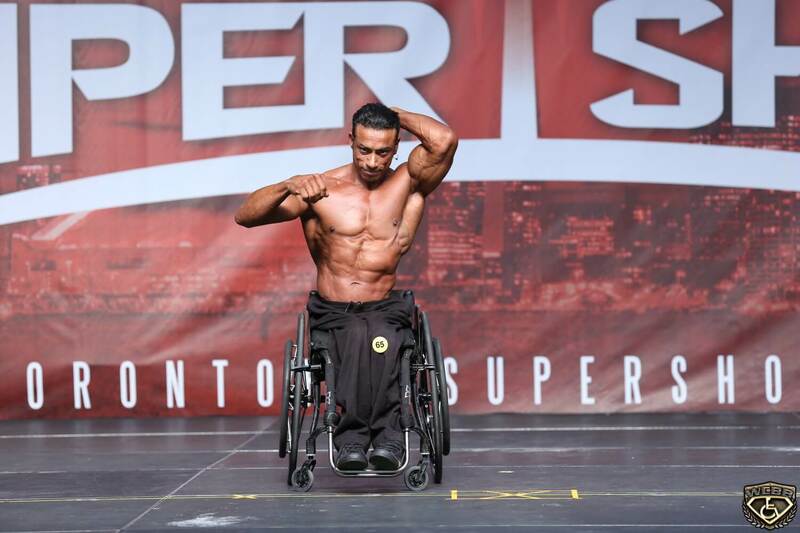 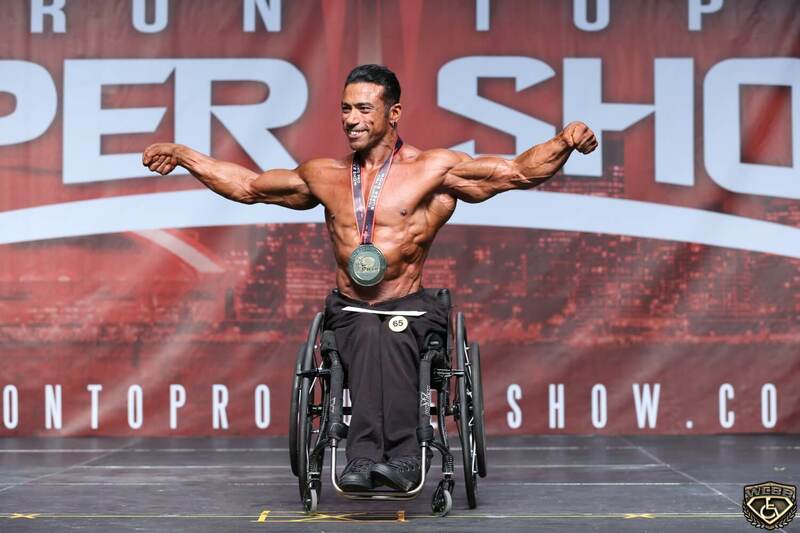 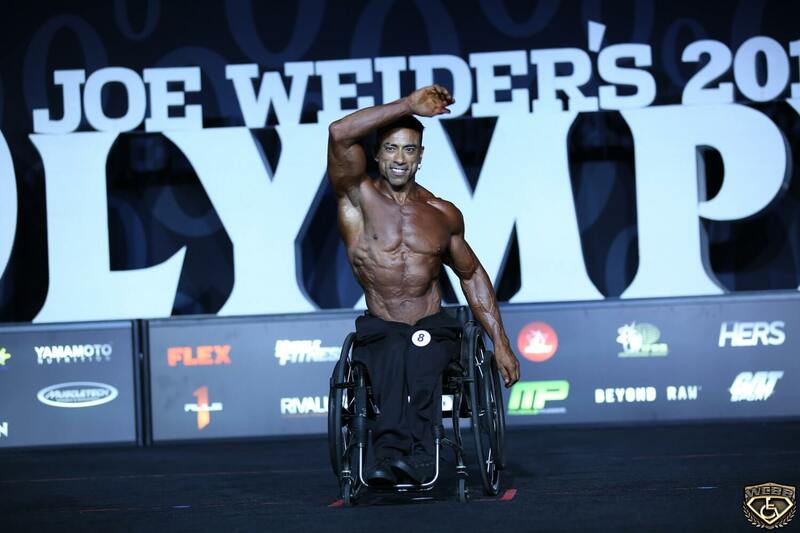 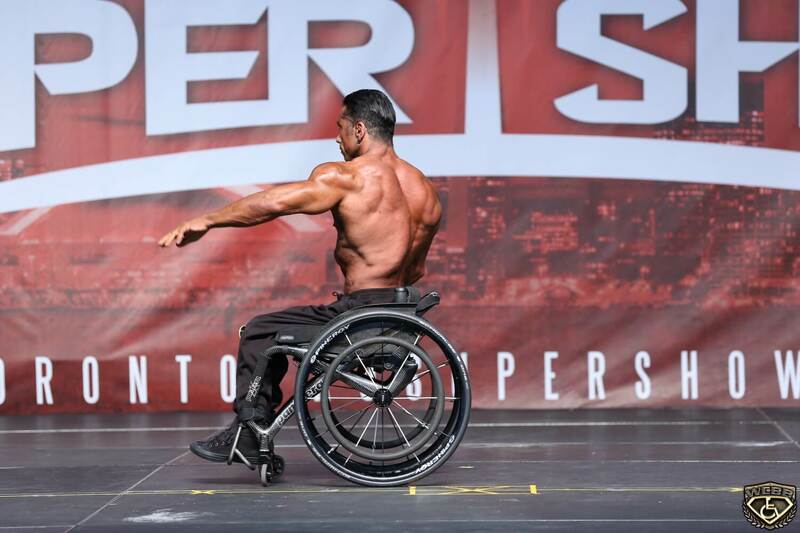 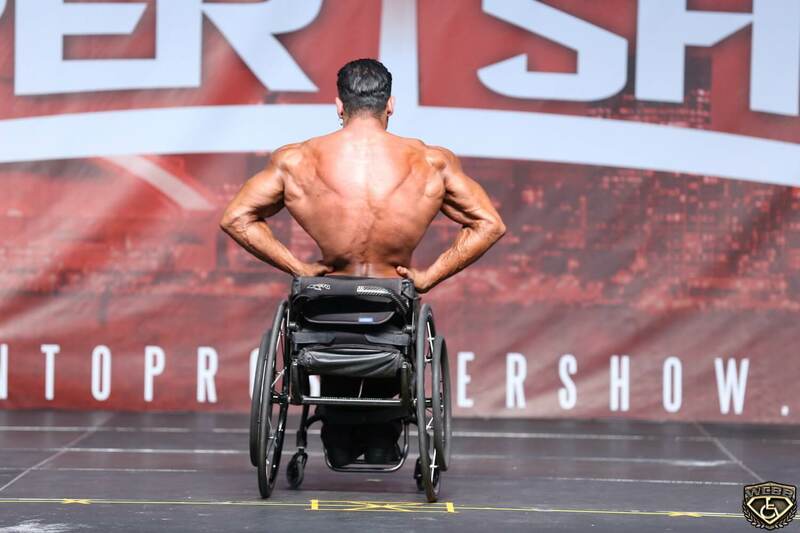 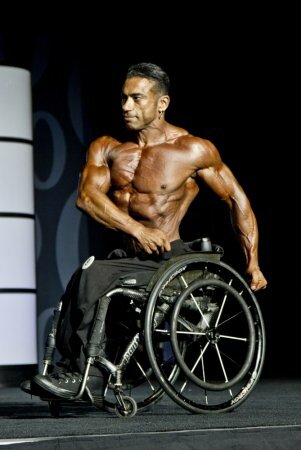 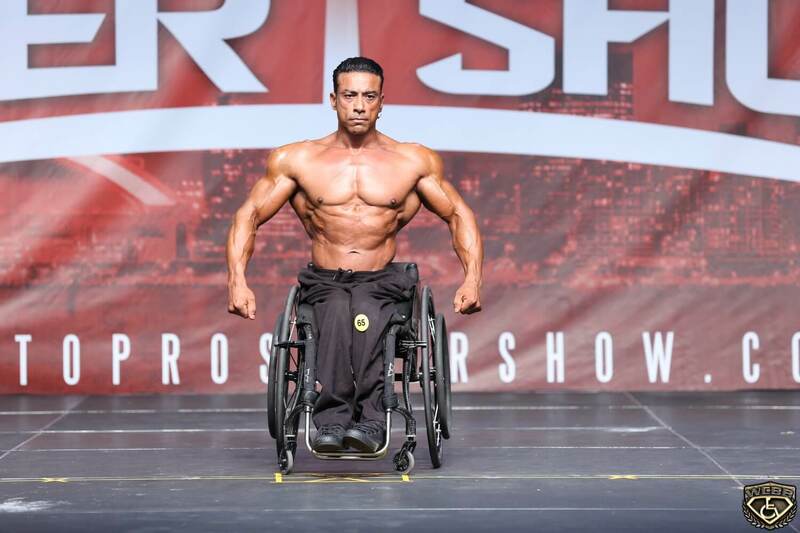 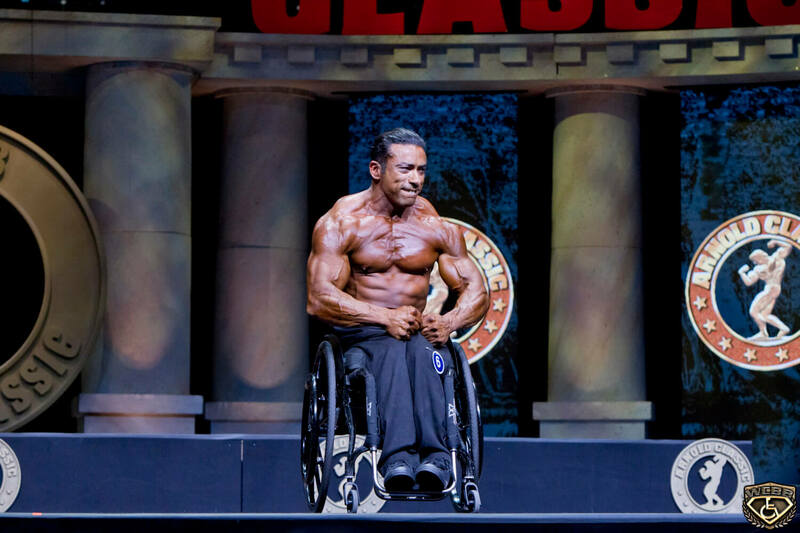 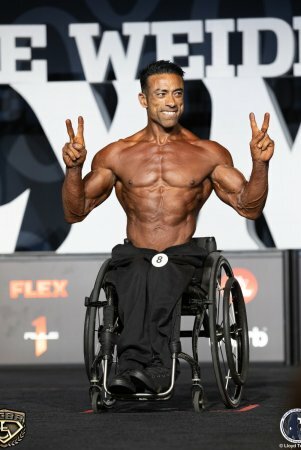 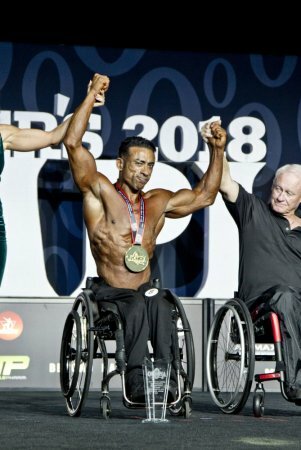 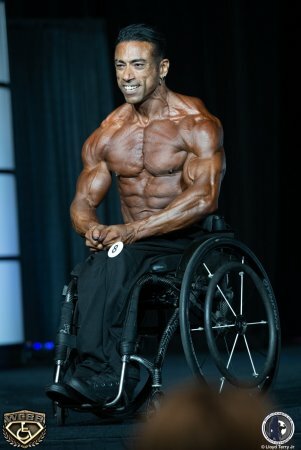 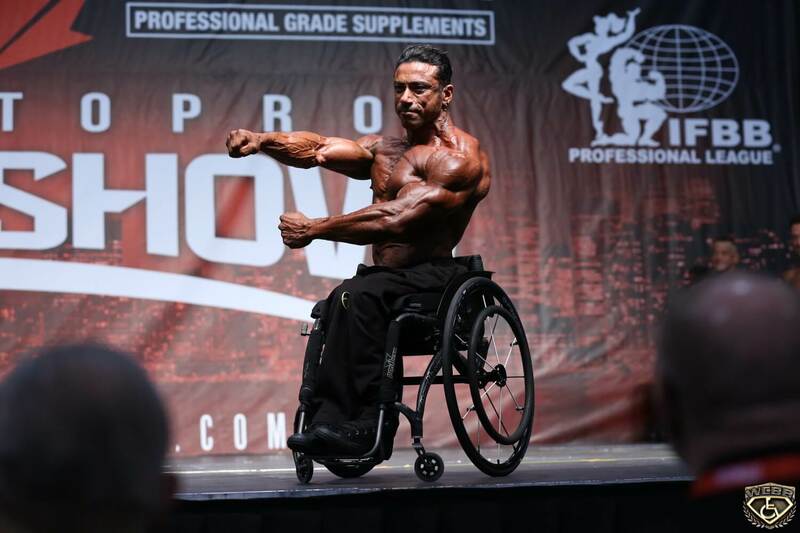 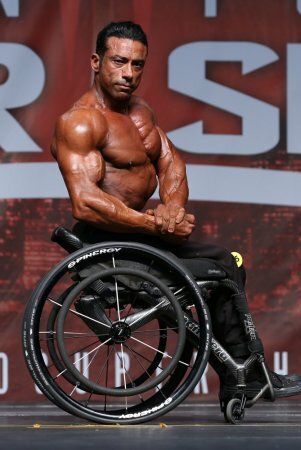 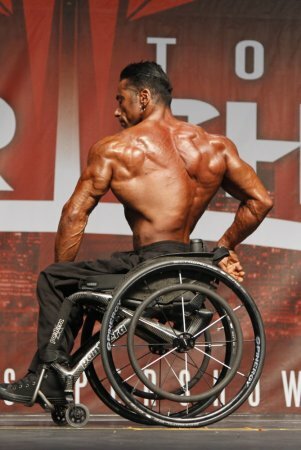 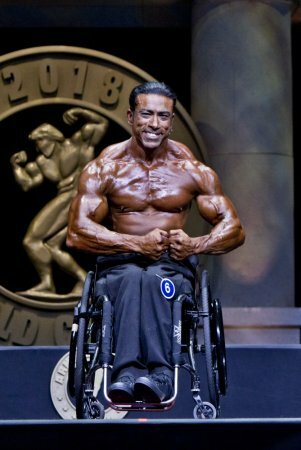 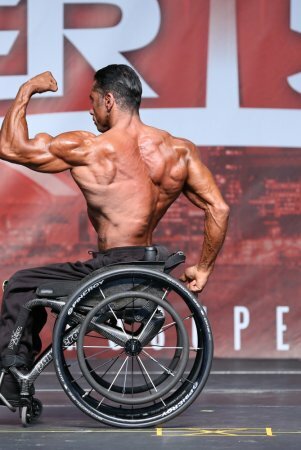 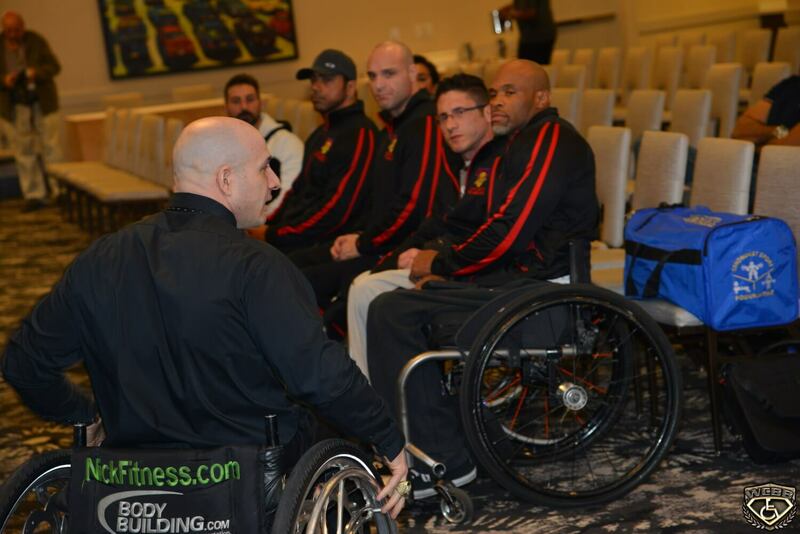 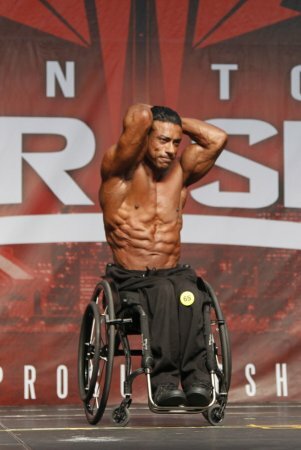 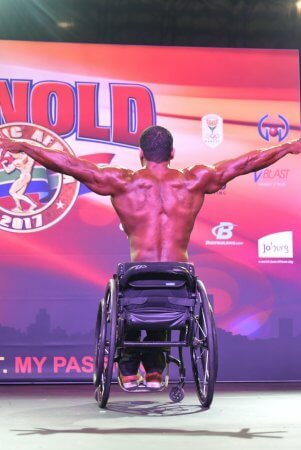 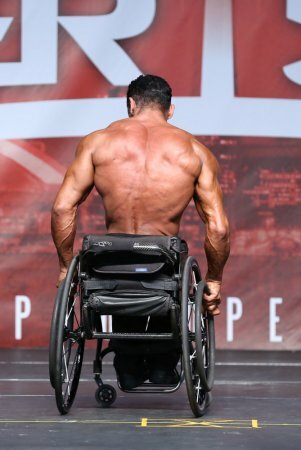 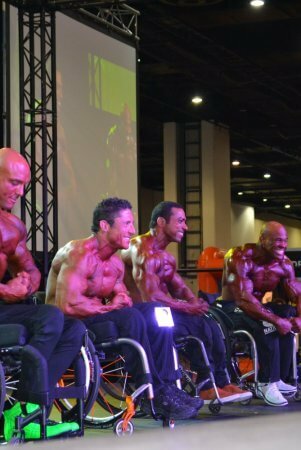 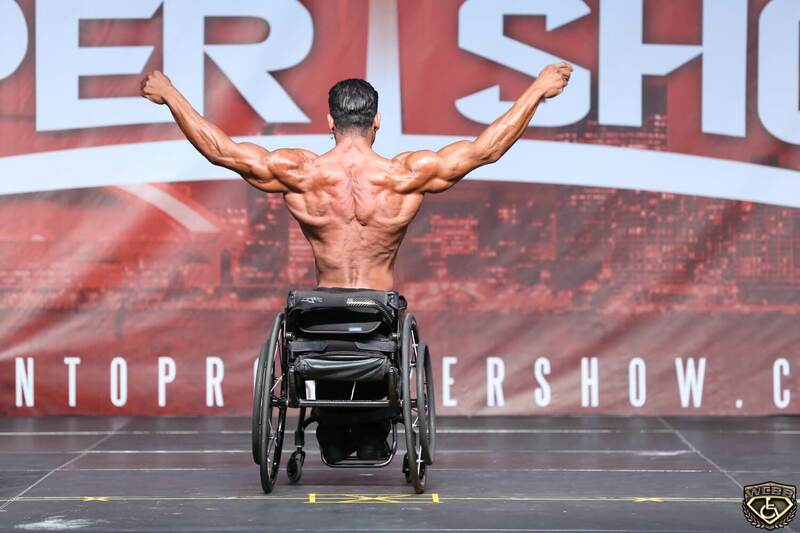 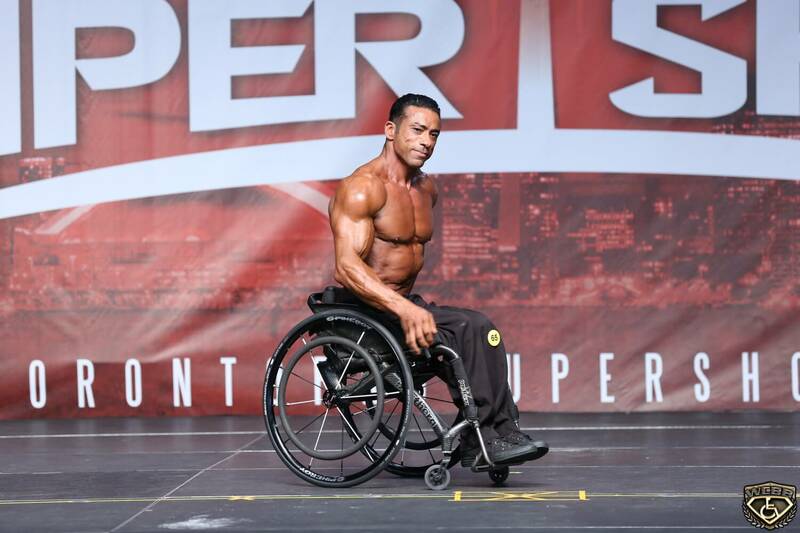 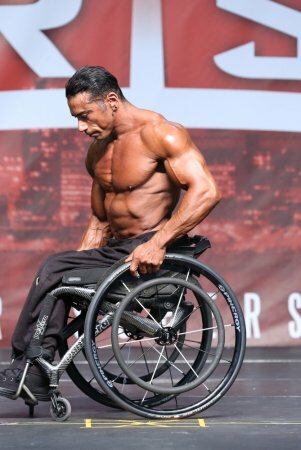 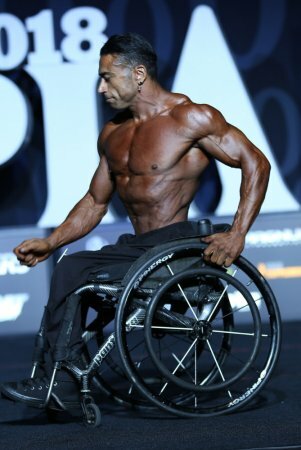 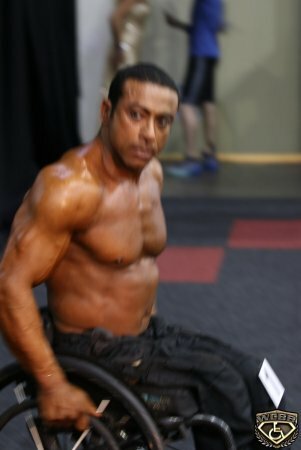 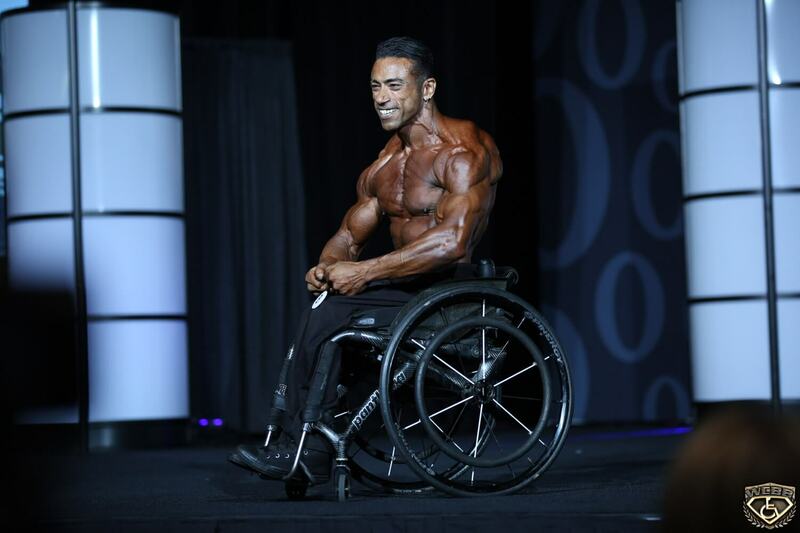 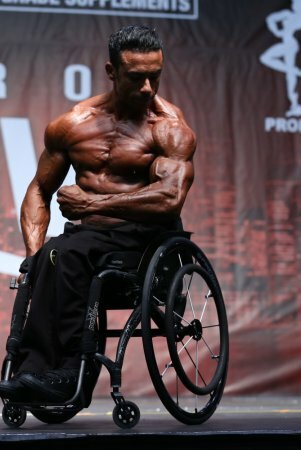 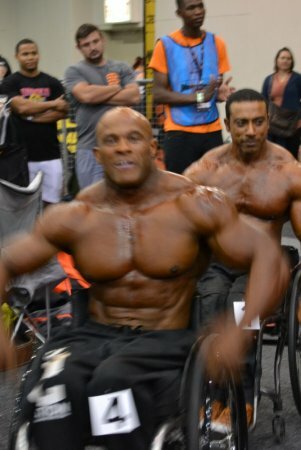 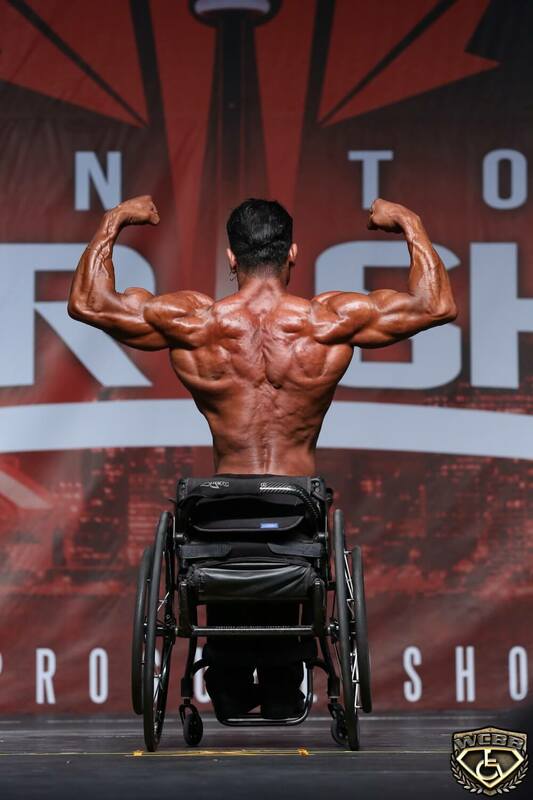 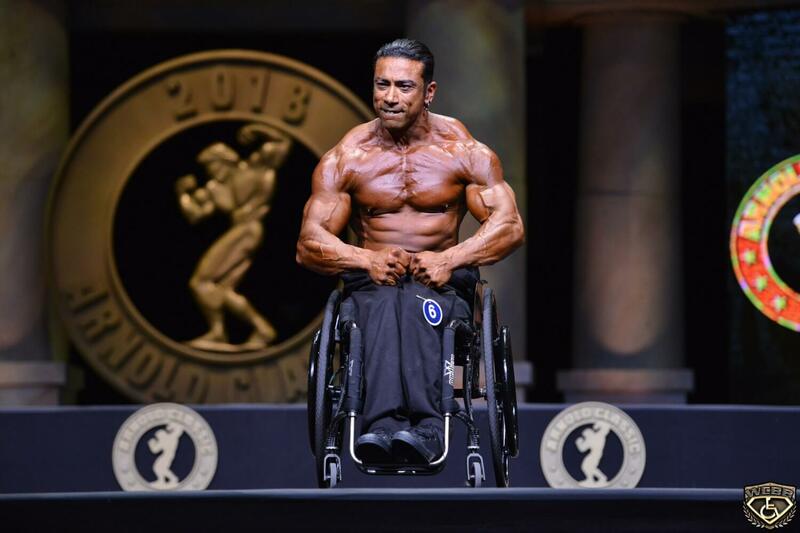 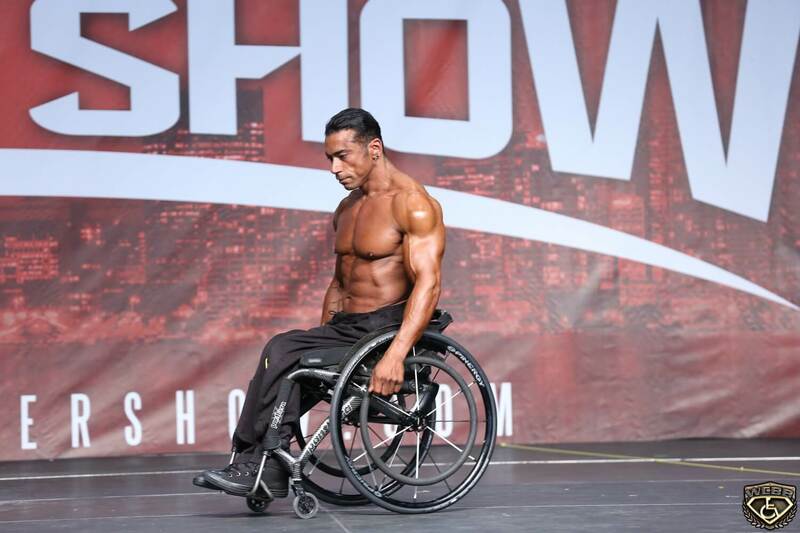 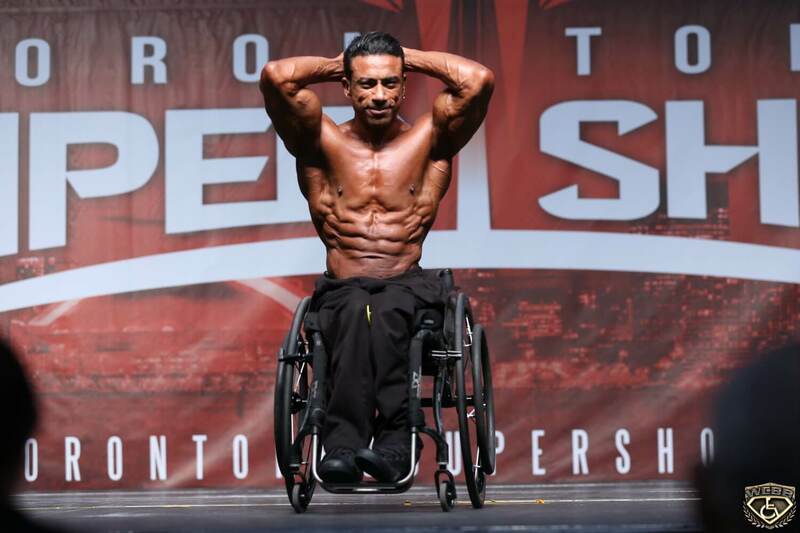 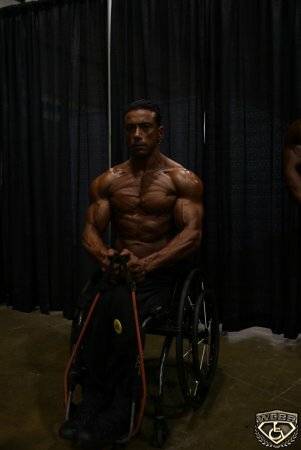 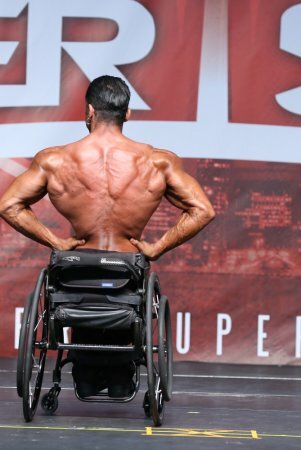 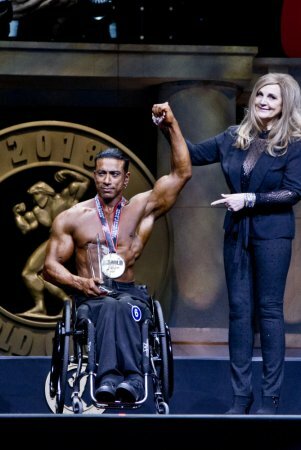 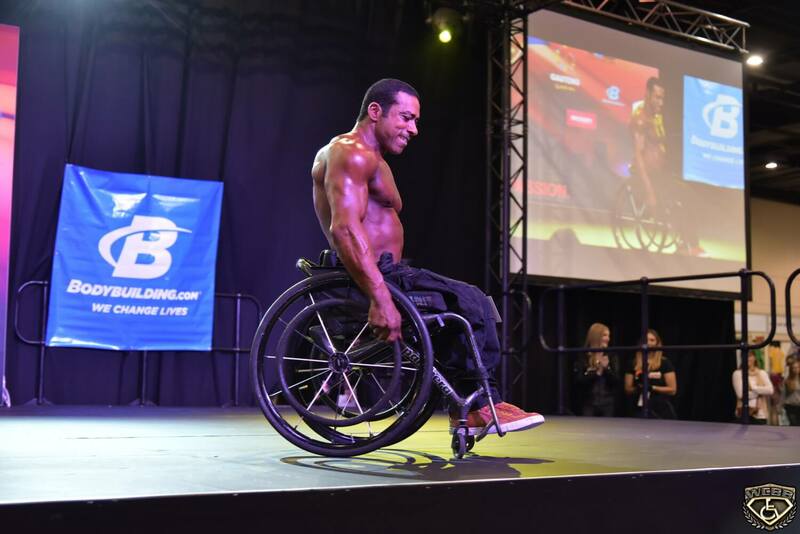 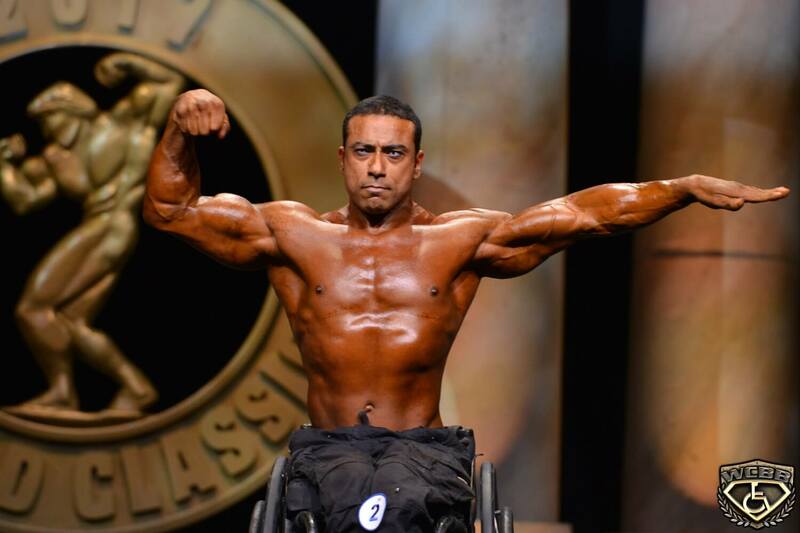 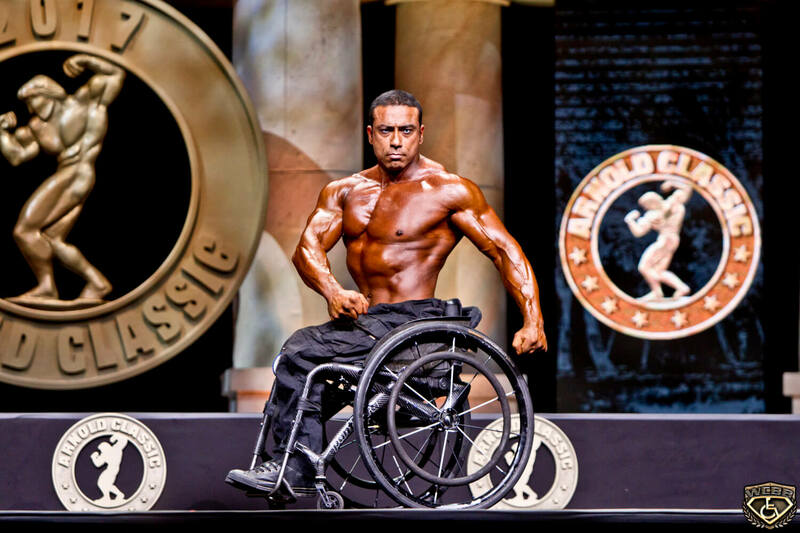 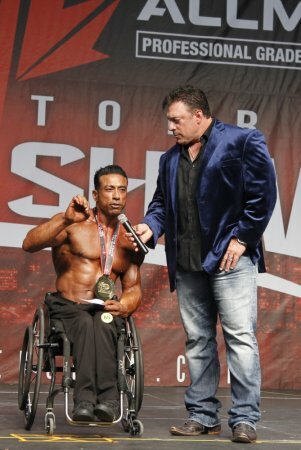 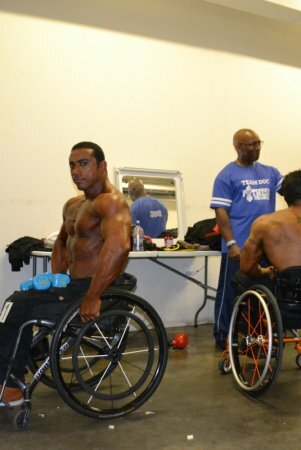 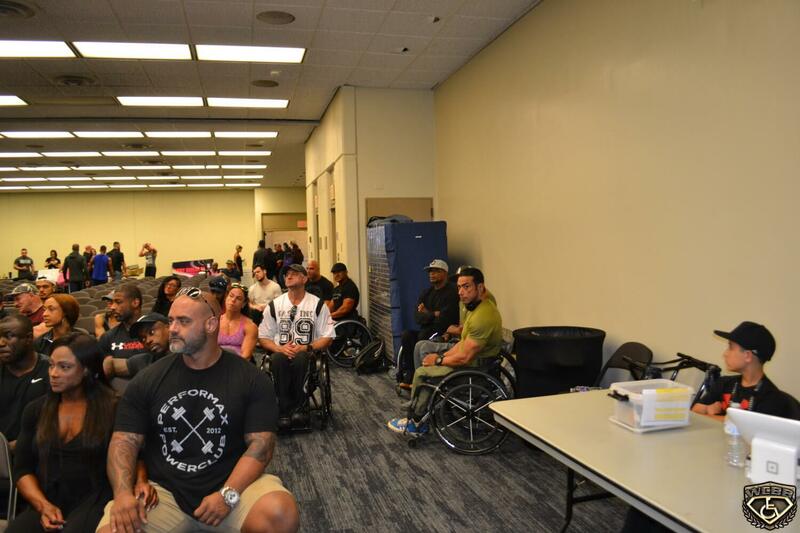 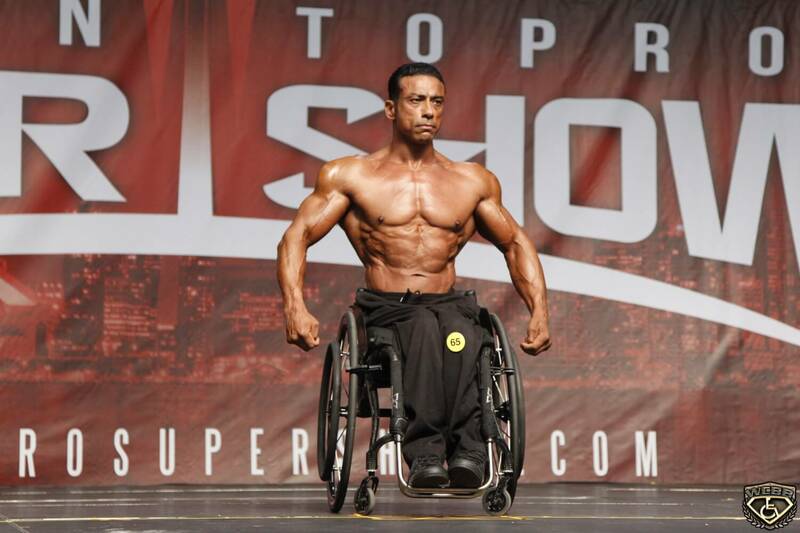 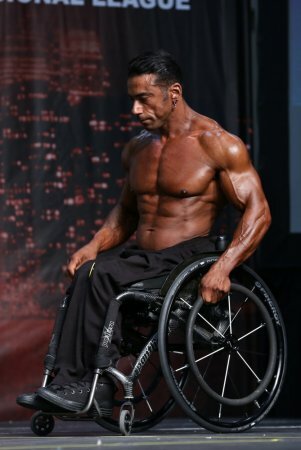 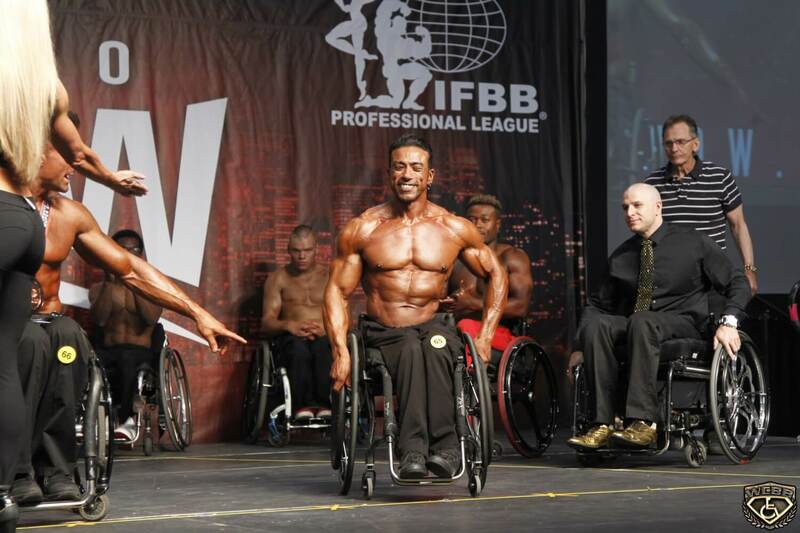 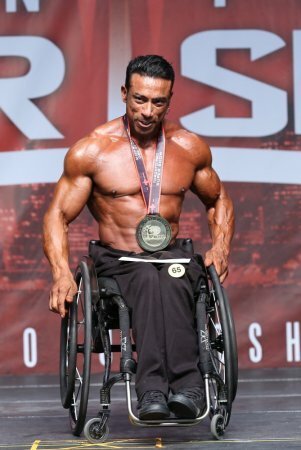 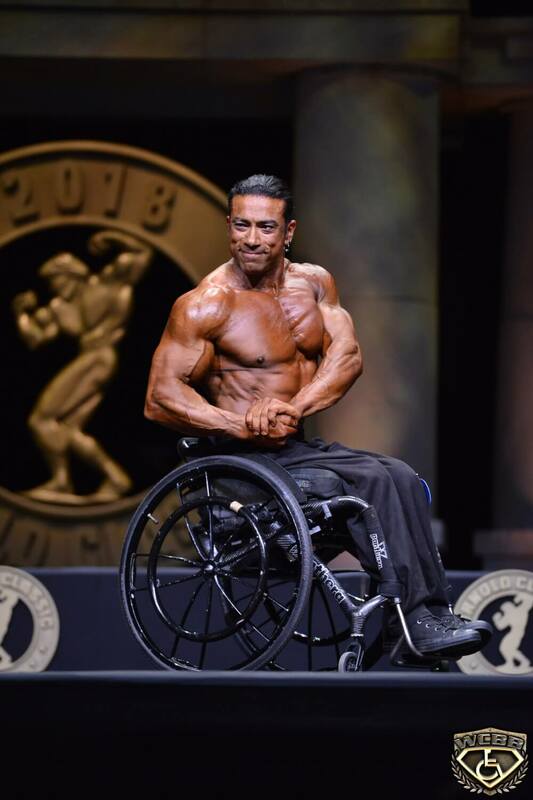 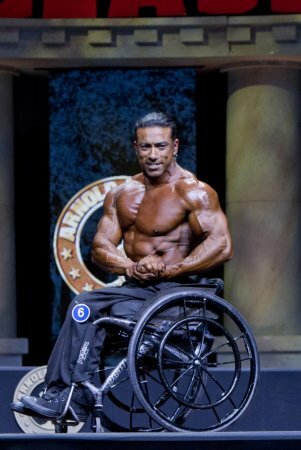 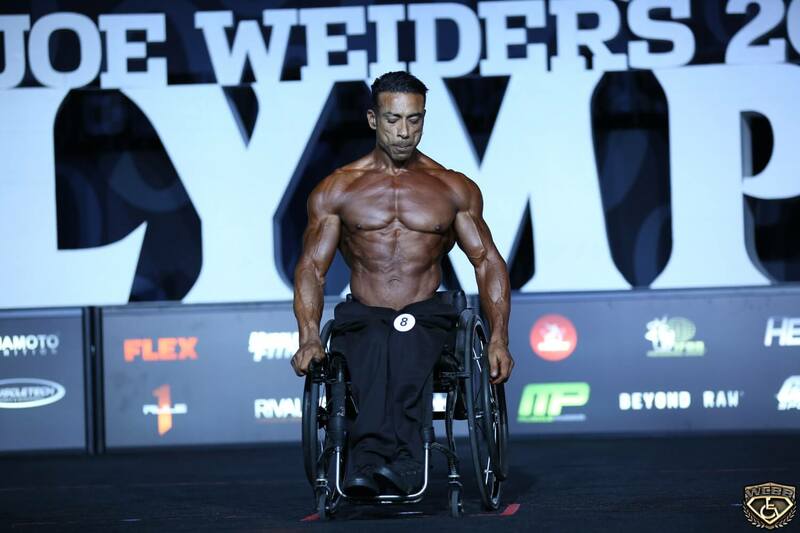 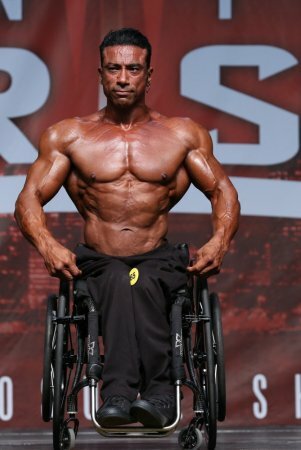 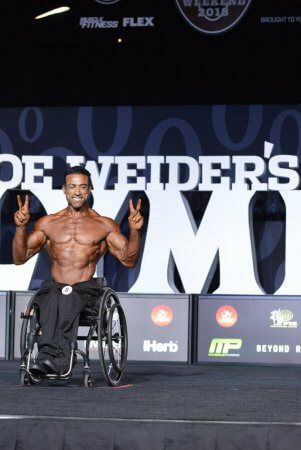 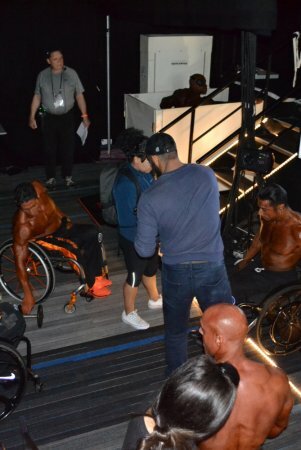 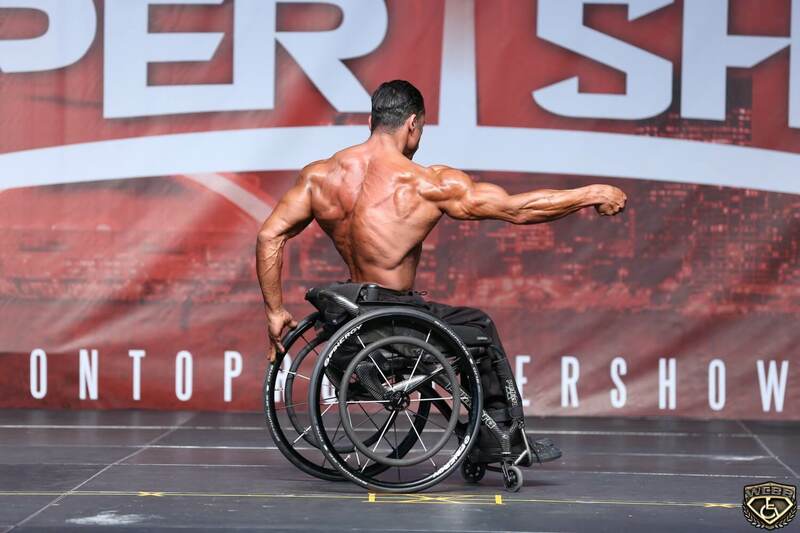 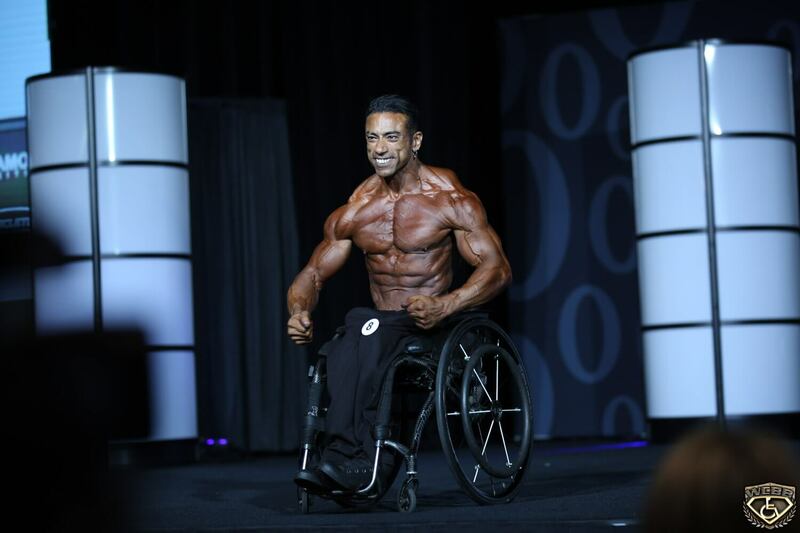 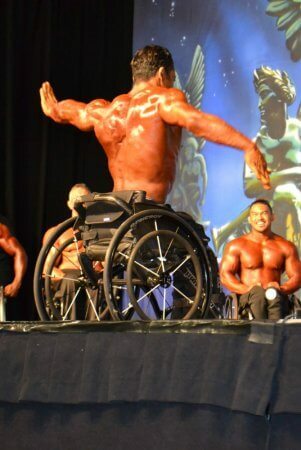 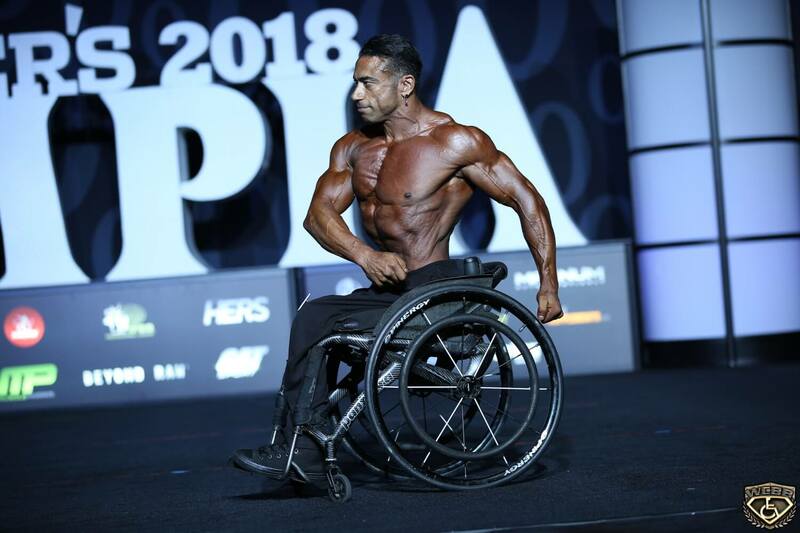 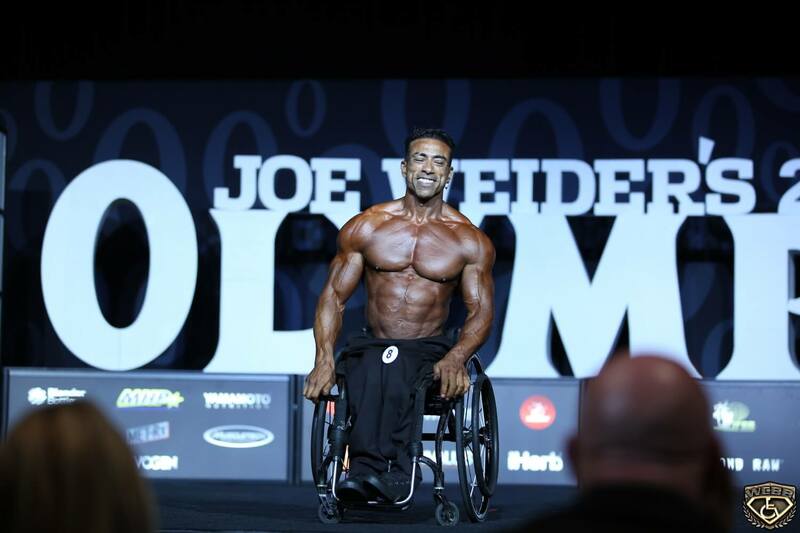 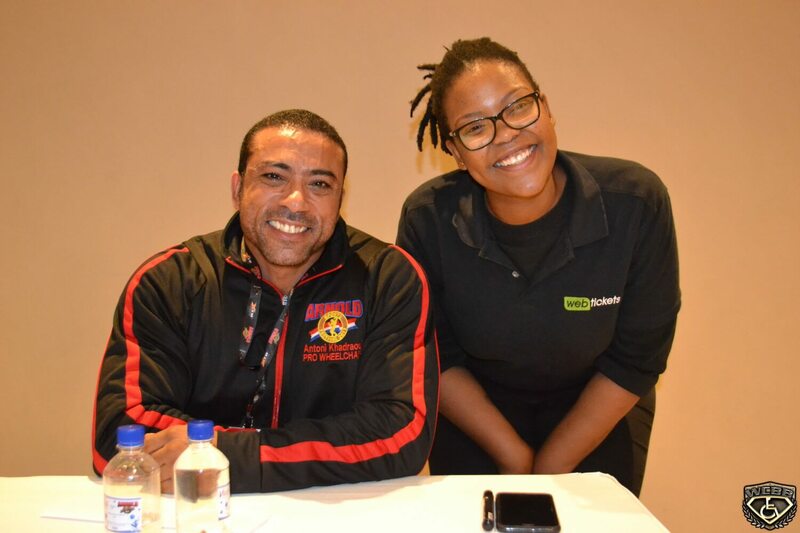 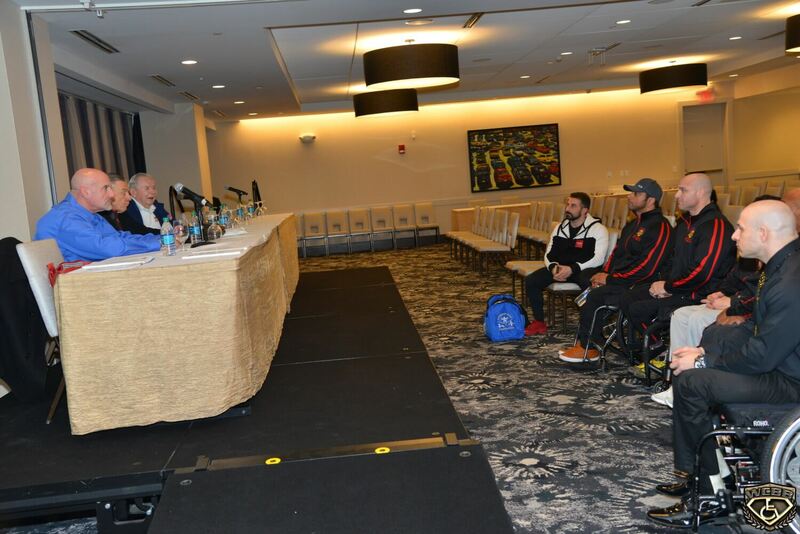 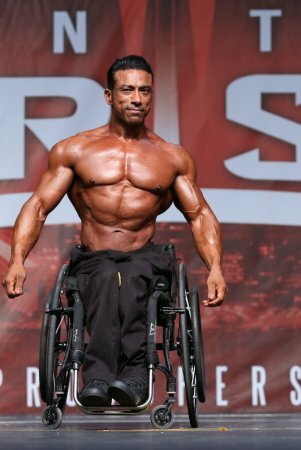 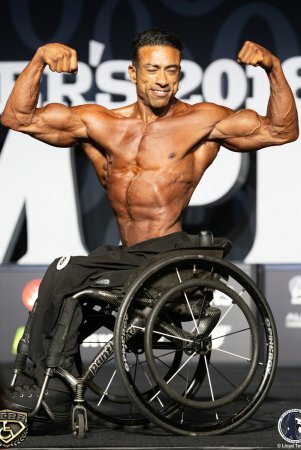 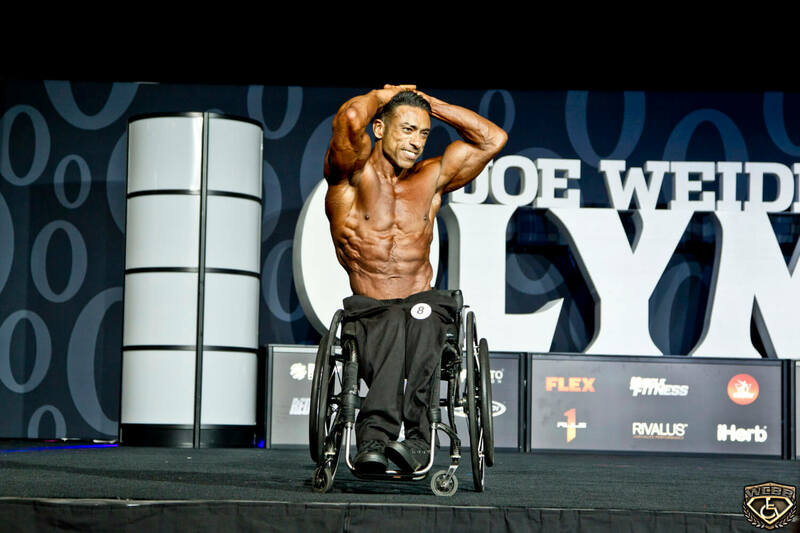 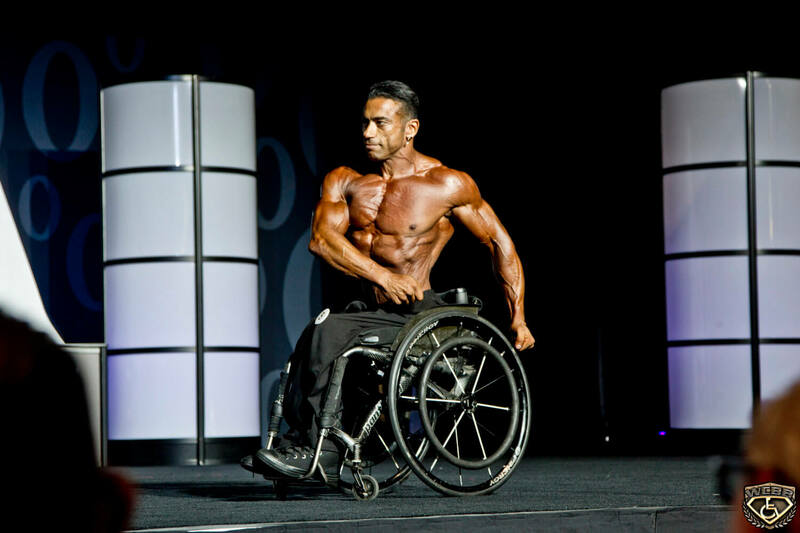 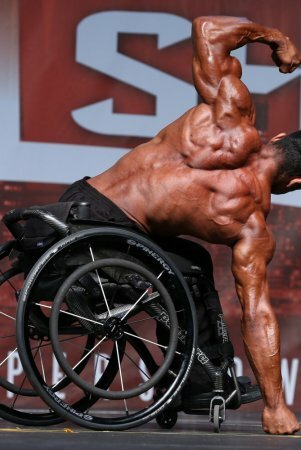 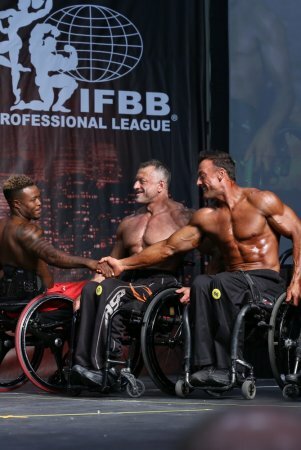 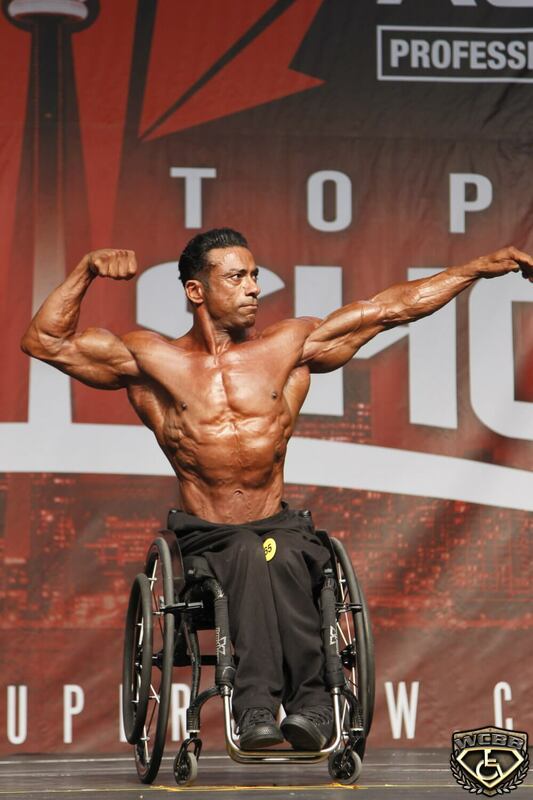 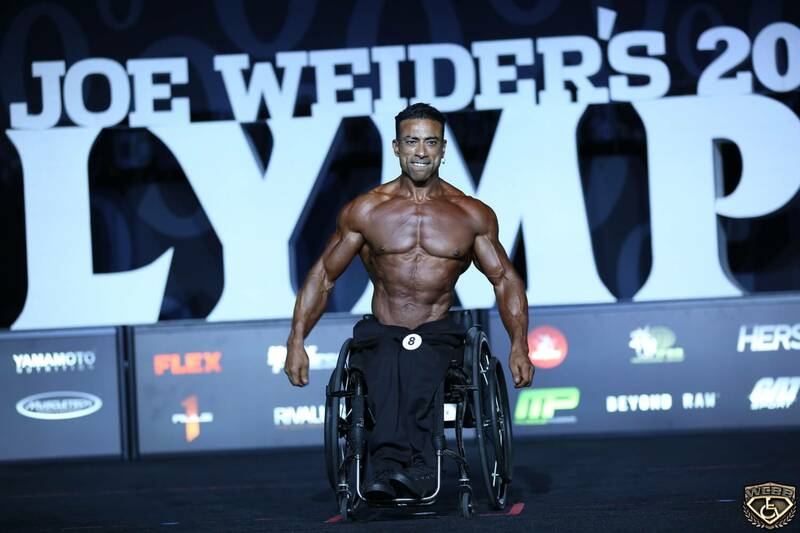 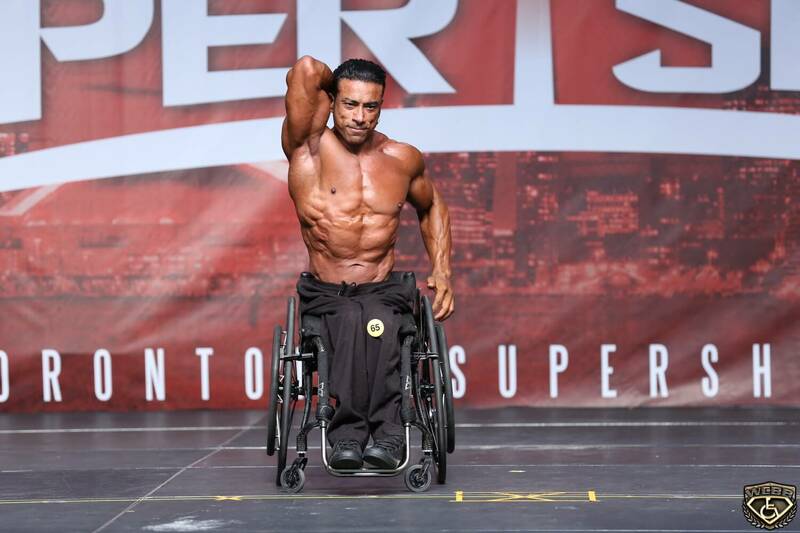 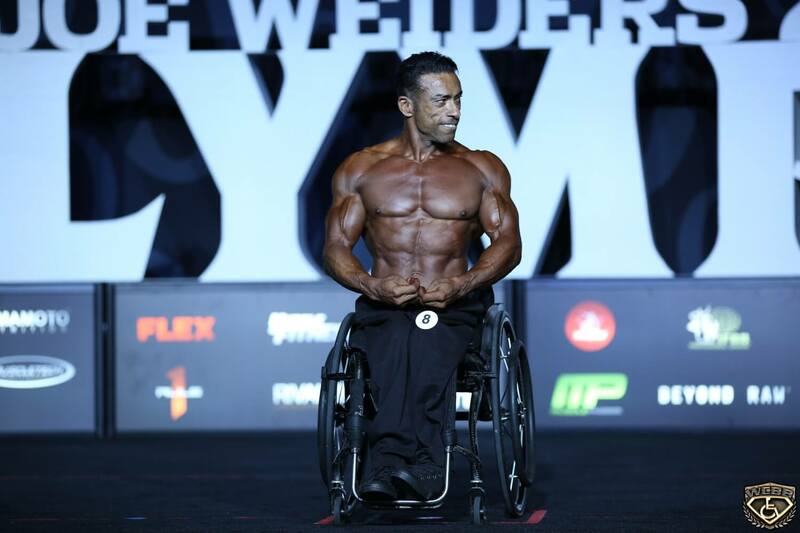 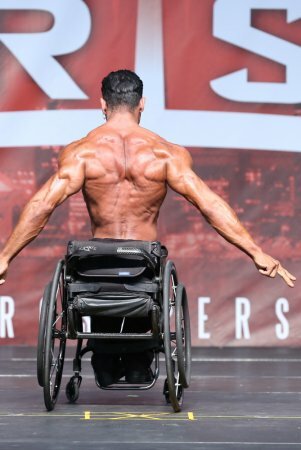 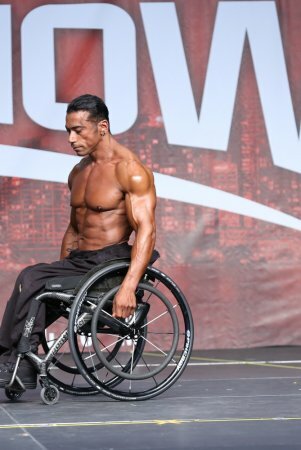 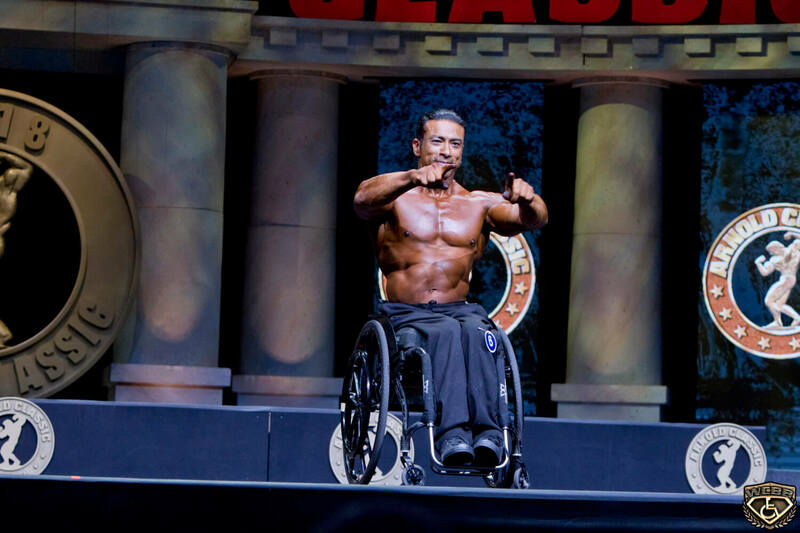 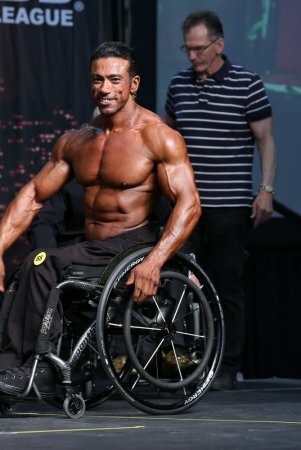 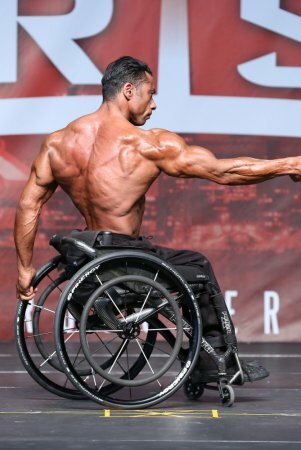 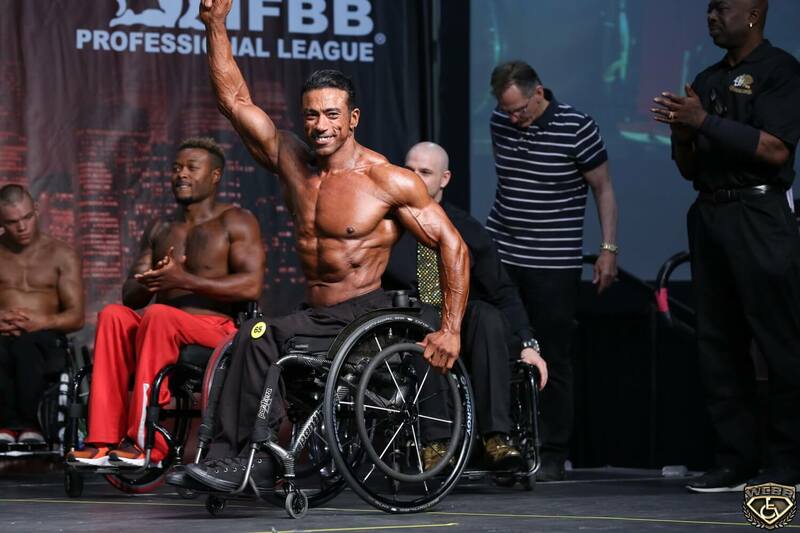 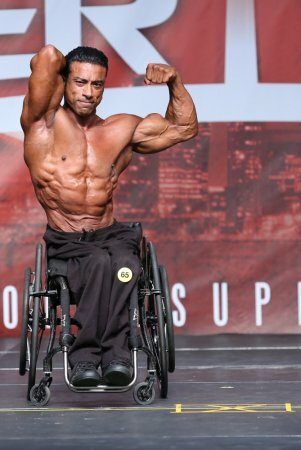 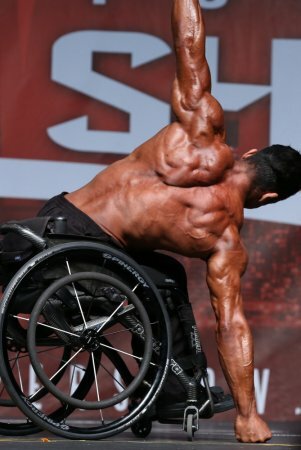 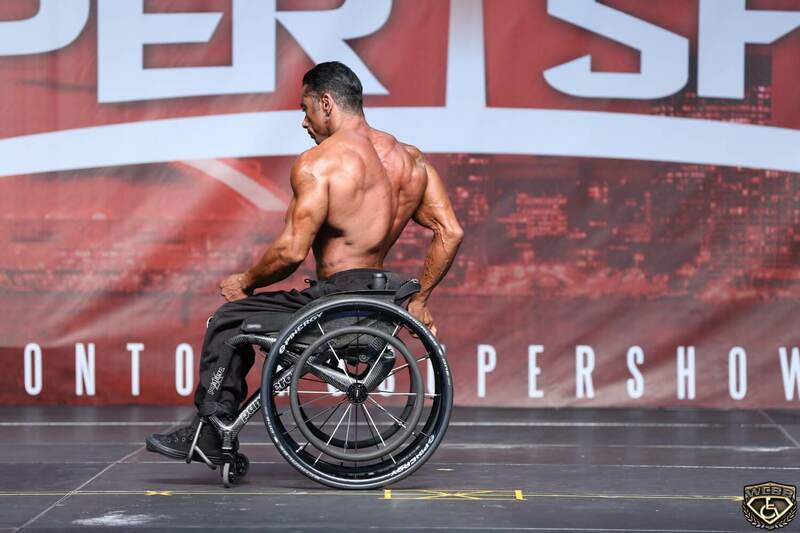 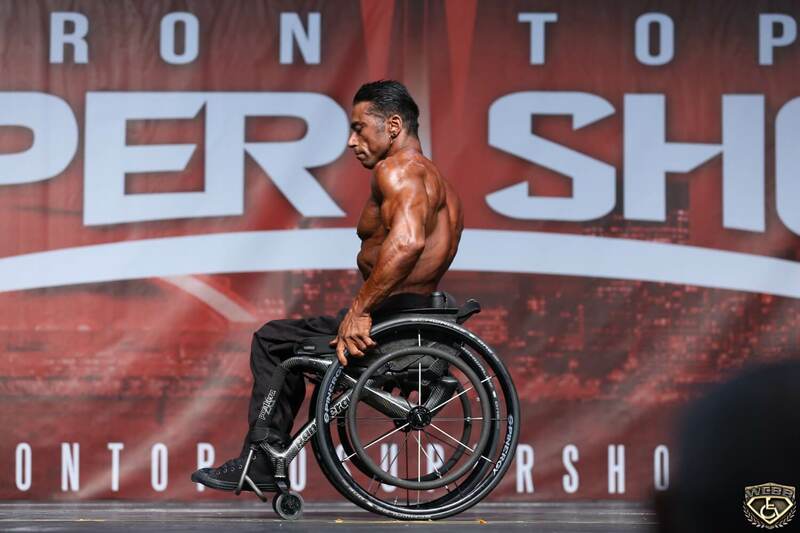 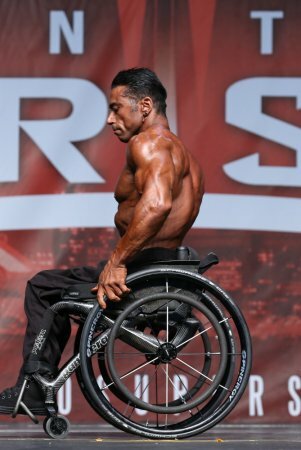 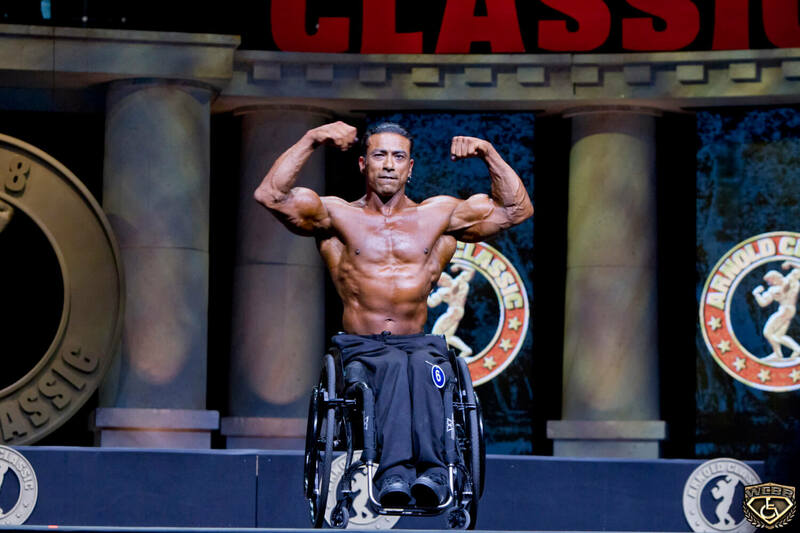 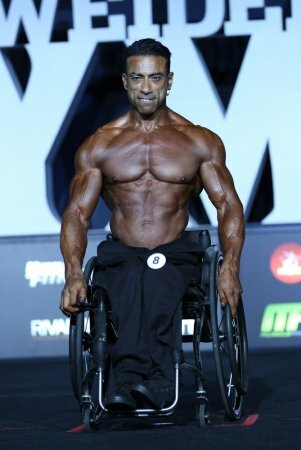 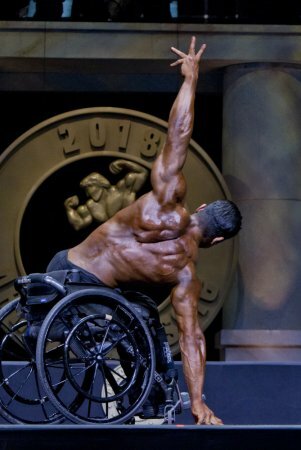 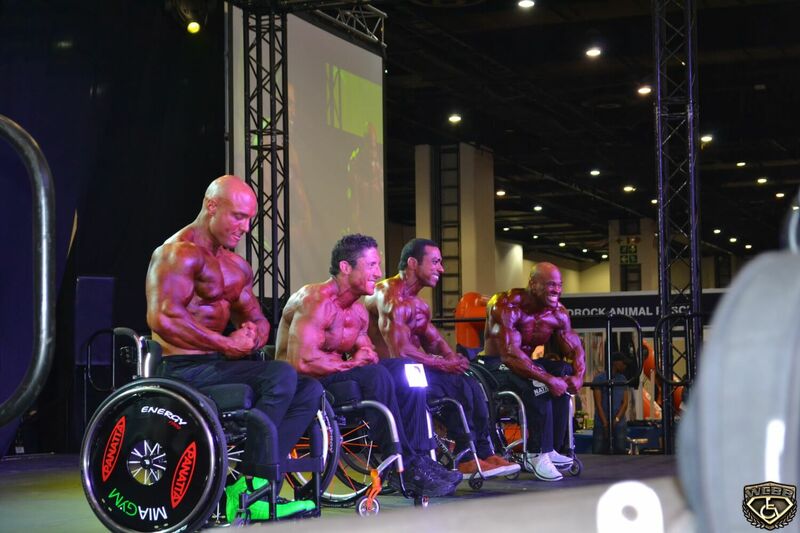 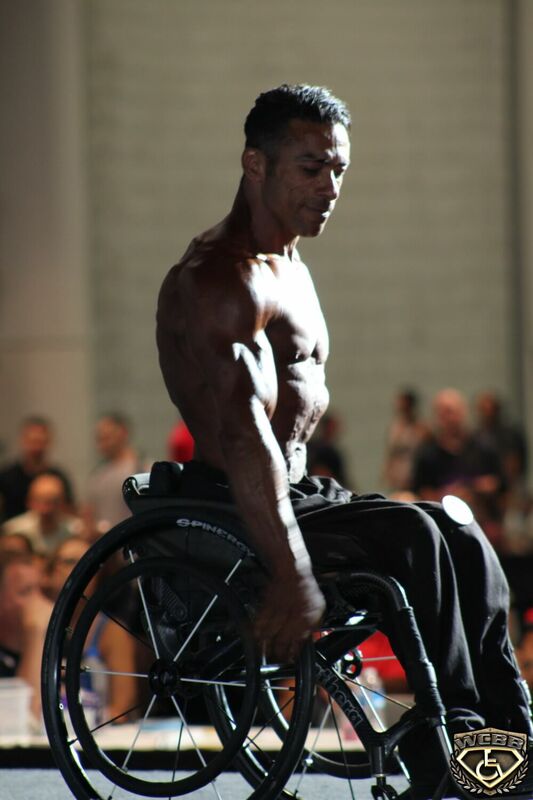 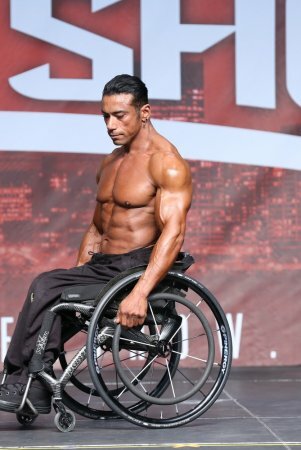 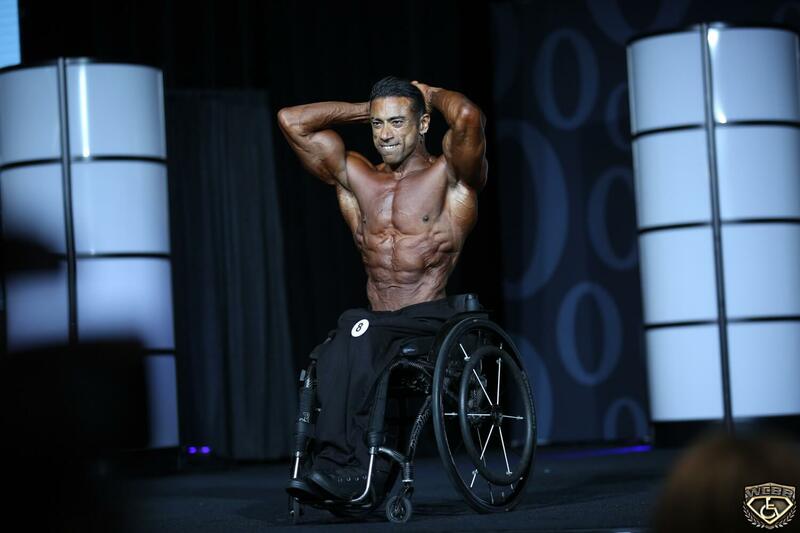 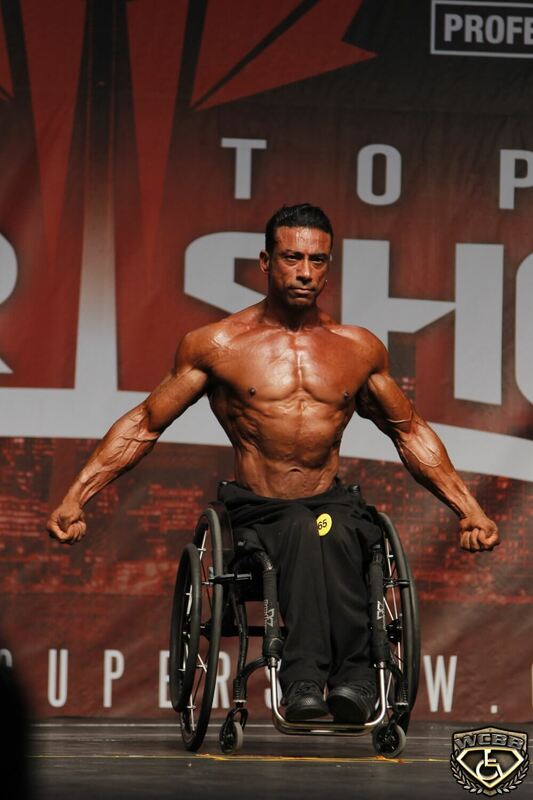 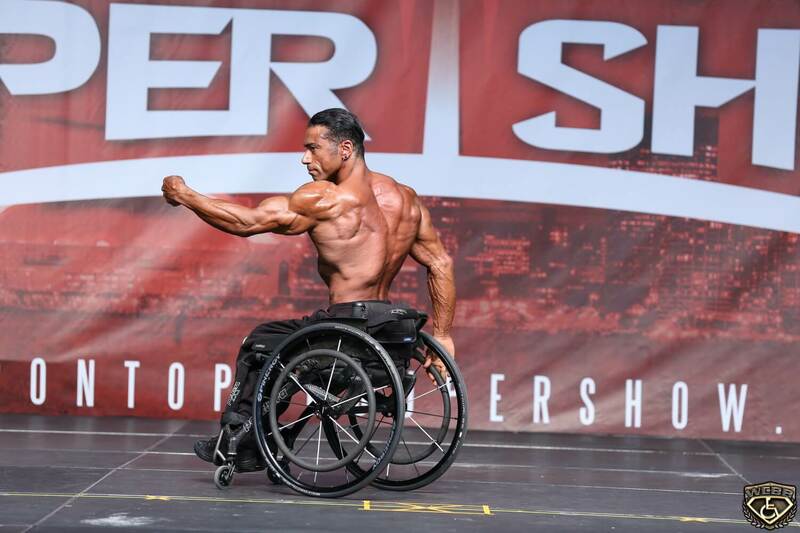 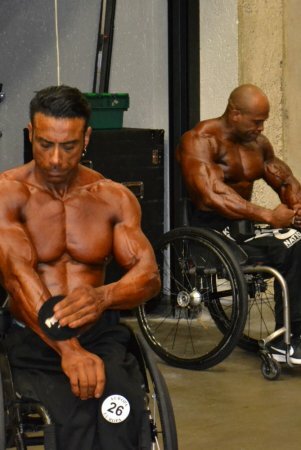 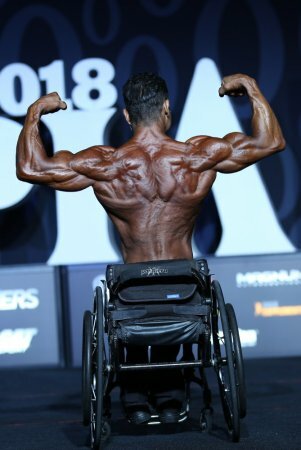 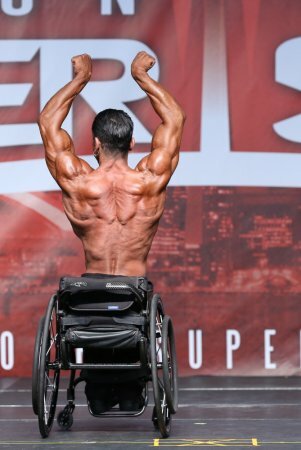 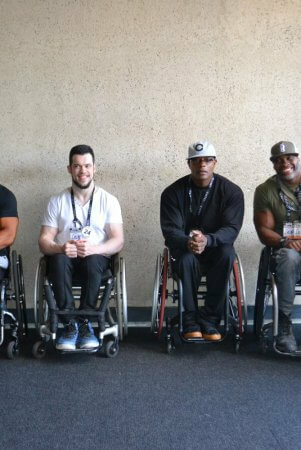 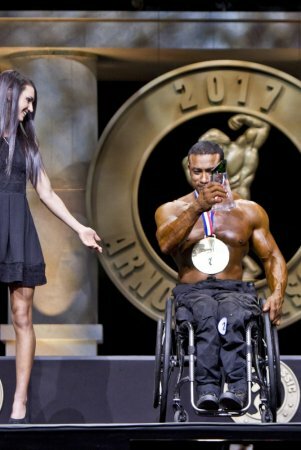 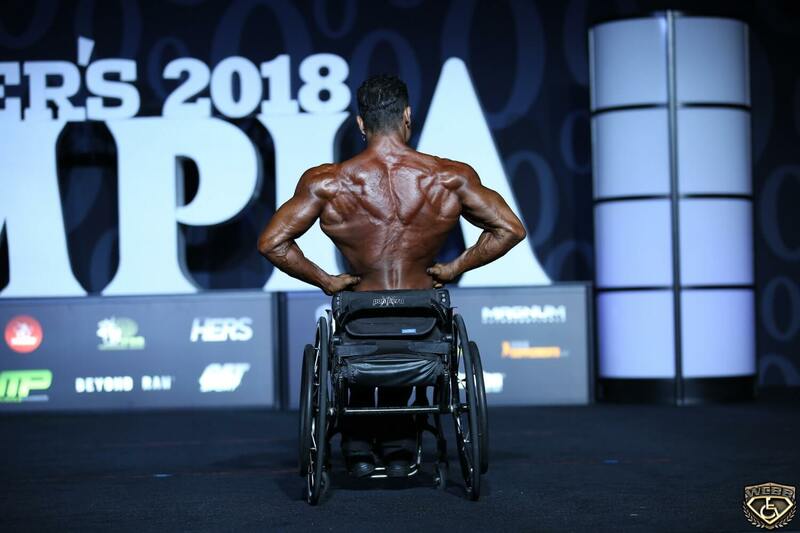 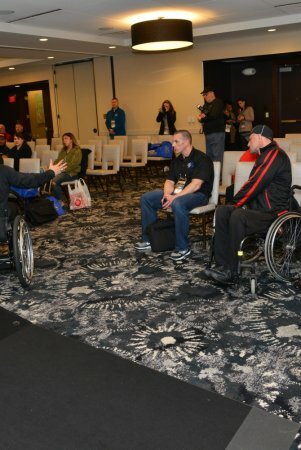 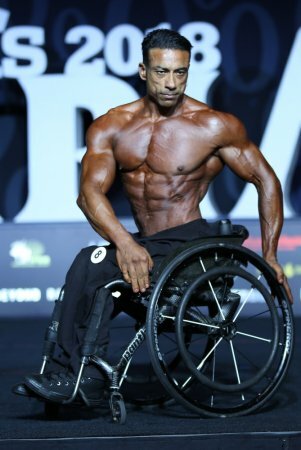 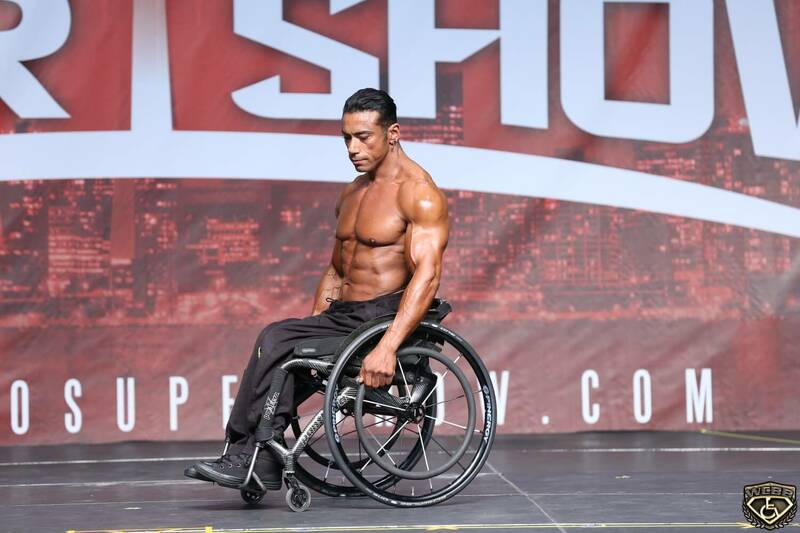 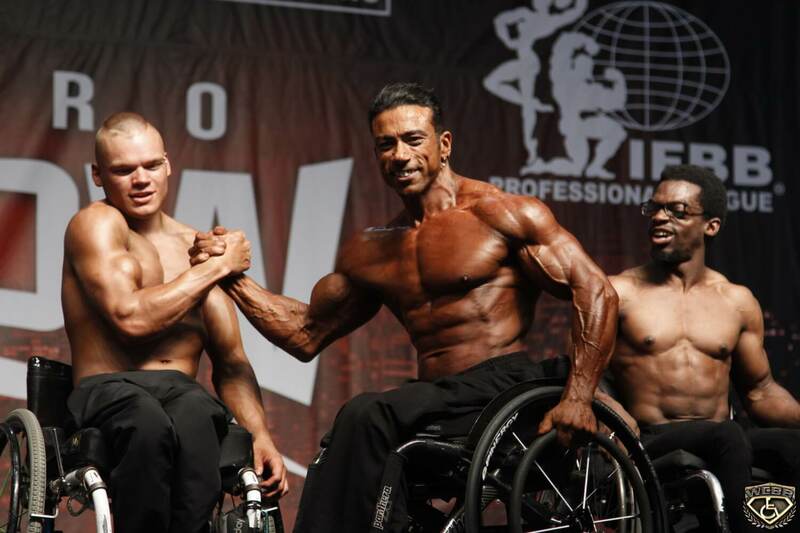 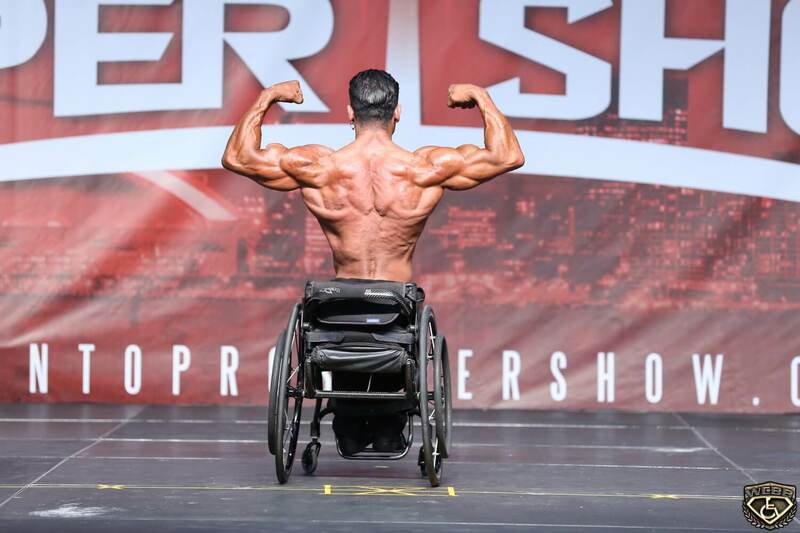 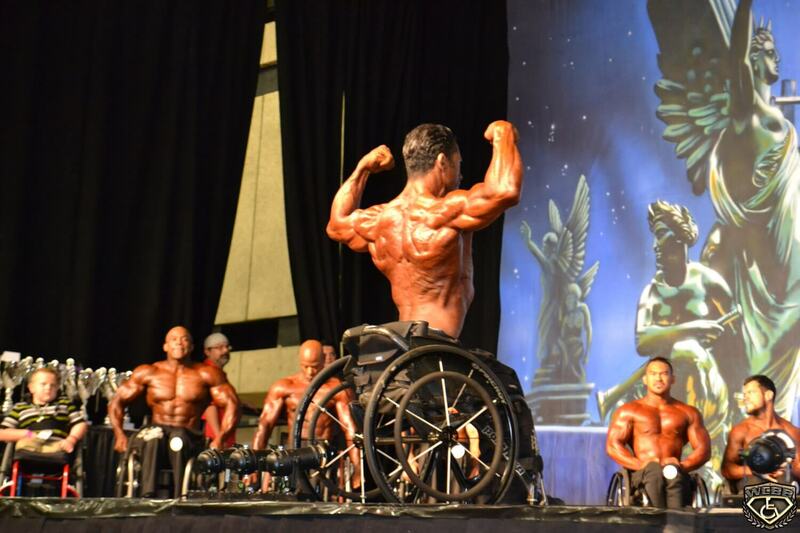 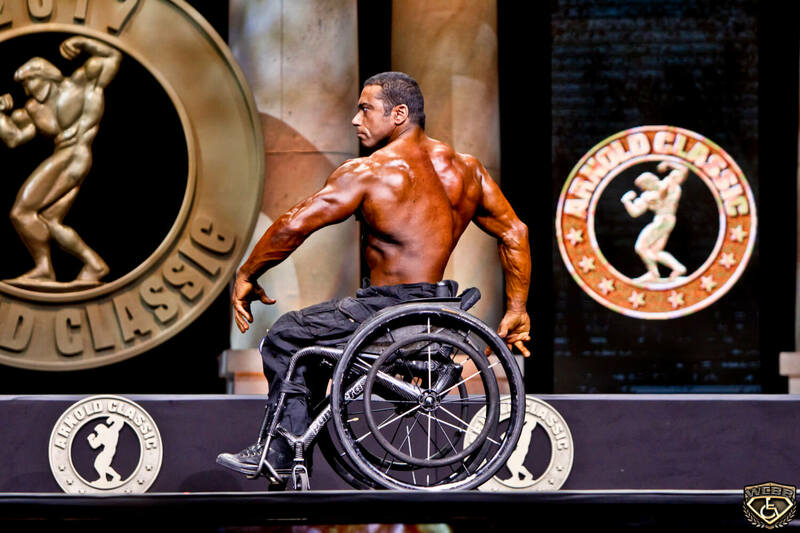 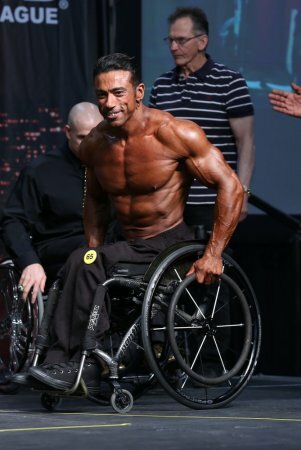 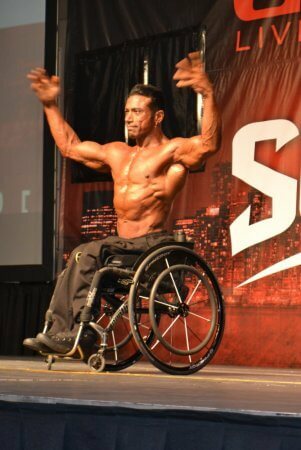 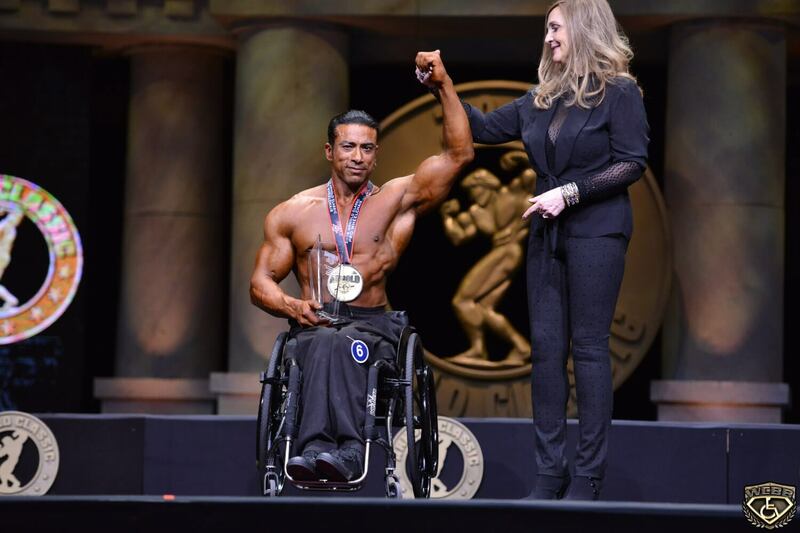 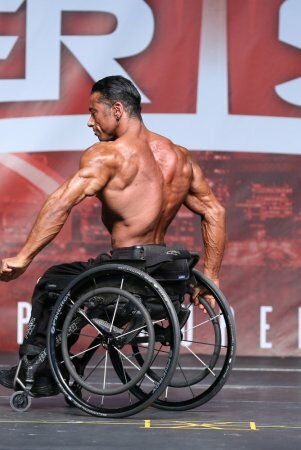 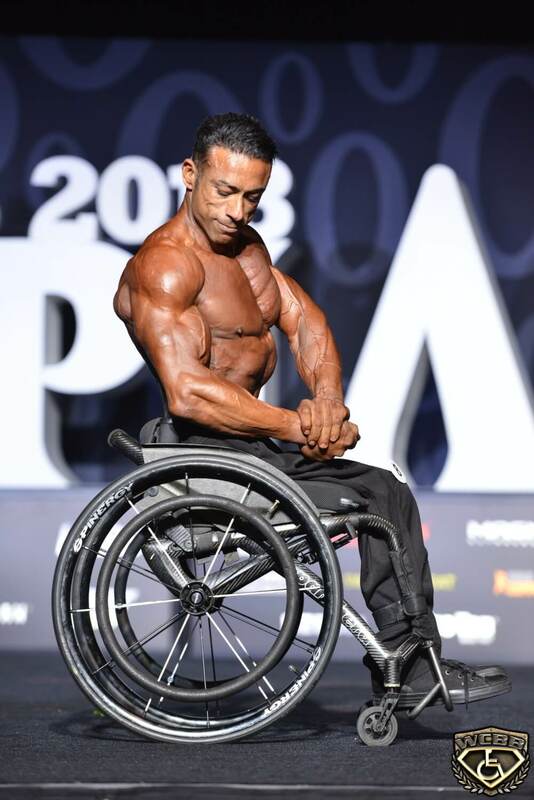 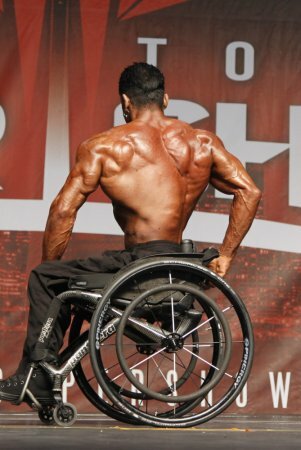 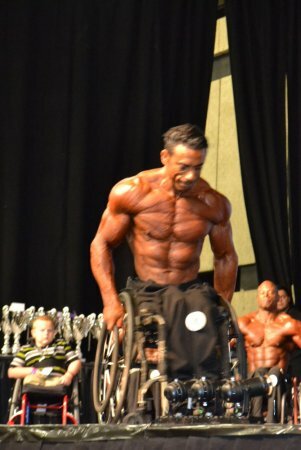 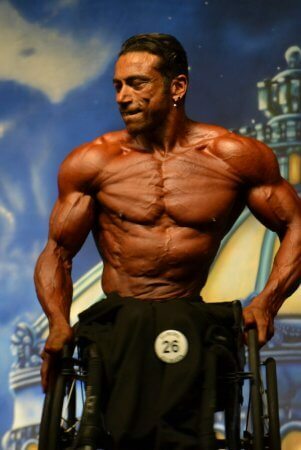 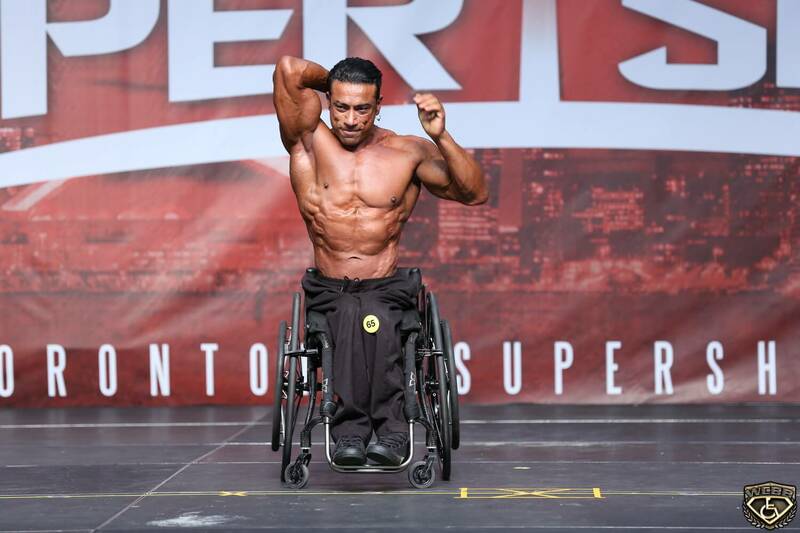 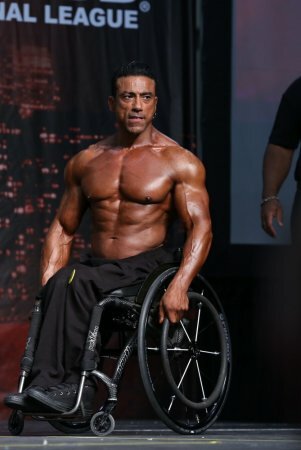 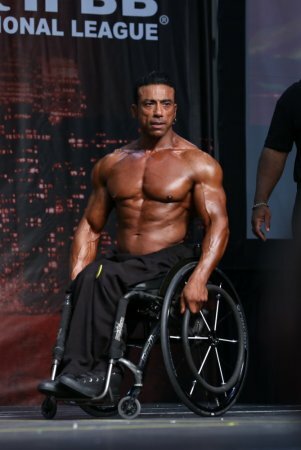 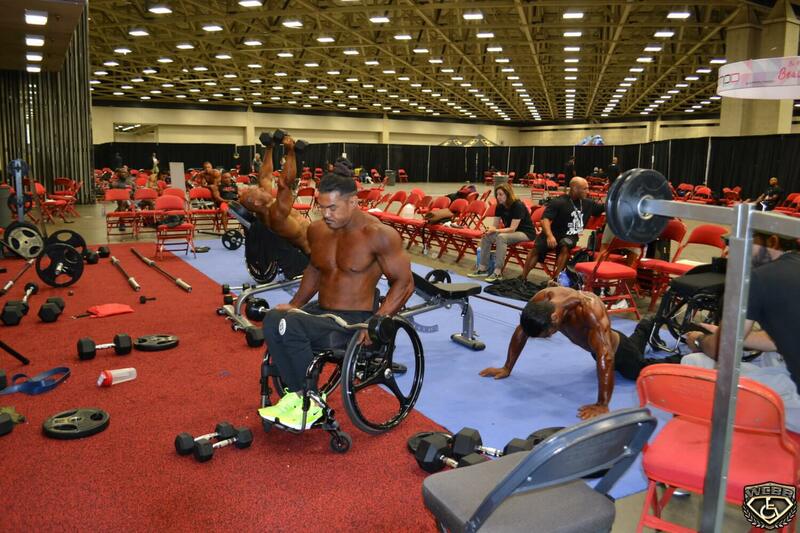 Many people thought that Antoni would not be able to handle bodybuilding and all that it entailed due to his paralysis and being in the wheelchair. The doubts were the secret to his motivations. 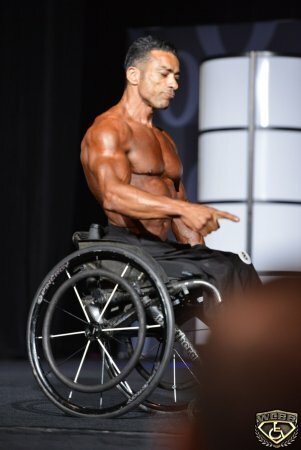 Telling him that he could not accomplish tasks were the exact keys to his motivation. 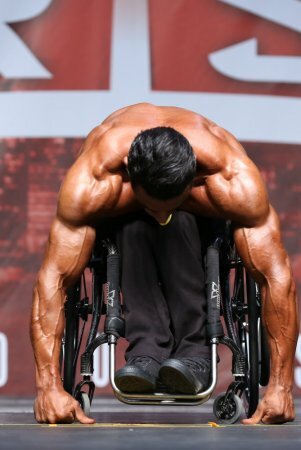 It made him work even that much harder to prove people wrong and to help him meet the goals that he had sat for himself. 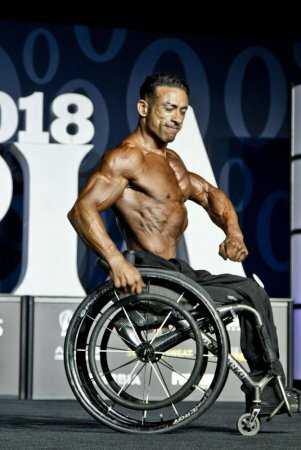 The thought of someone restricting his abilities gave him that more strength and helped to encourage him to set higher goals that he was able to meet. 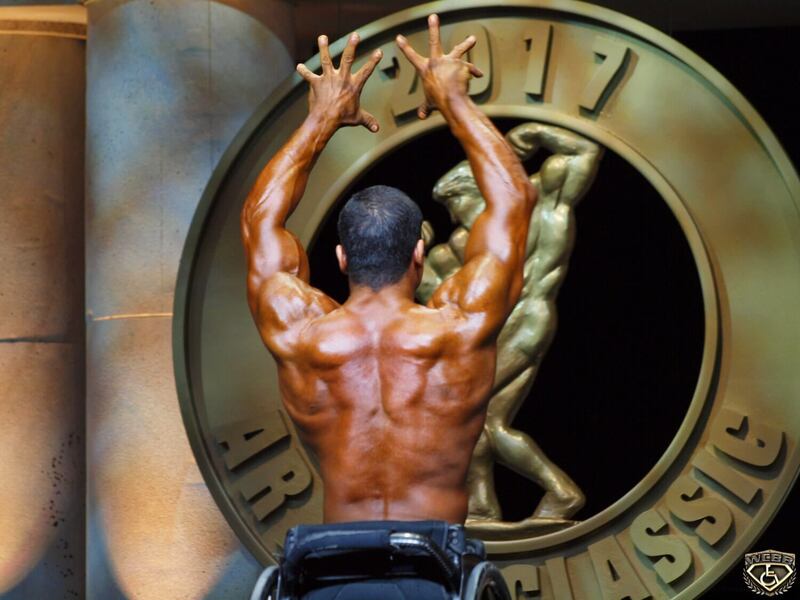 There is no such thing as a closed door to Antoni any doors that he has come across since his injury he has always been able to open. 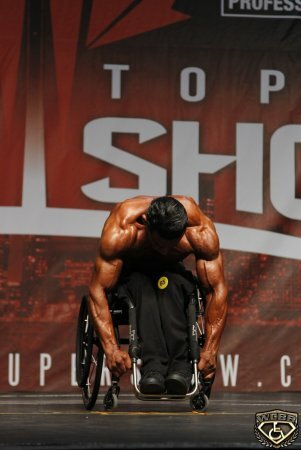 The more he is told that he can’t the more he strives to prove others wrong and show them that he can. 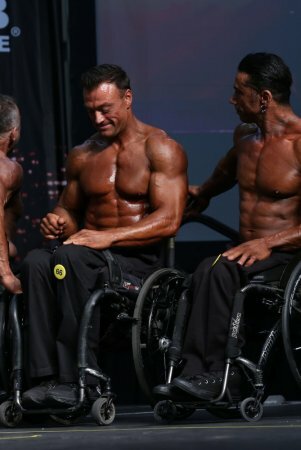 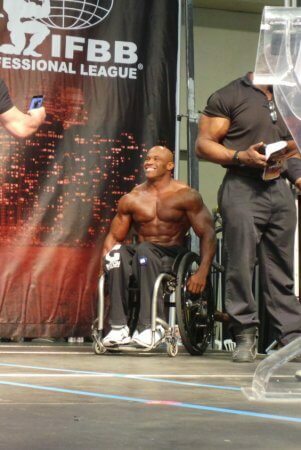 The feeling of being able to overcome the accident and become a bodybuilder brings him a great sense of pride that he is proud of. During the times when he is in competition and competing, he keeps his weight between 70 and 72kgs and when he is not competing during the offseason his ideal weight is 63kgs. 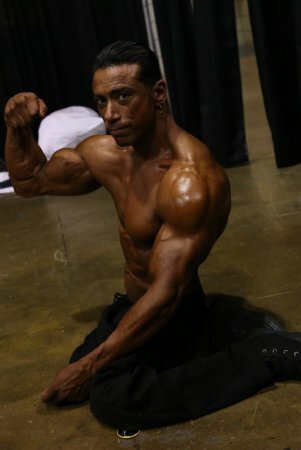 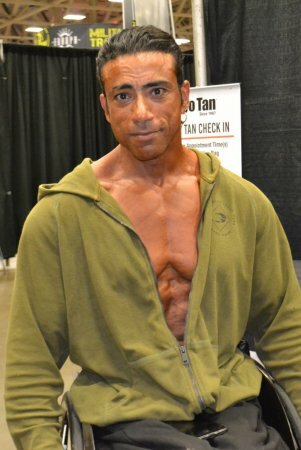 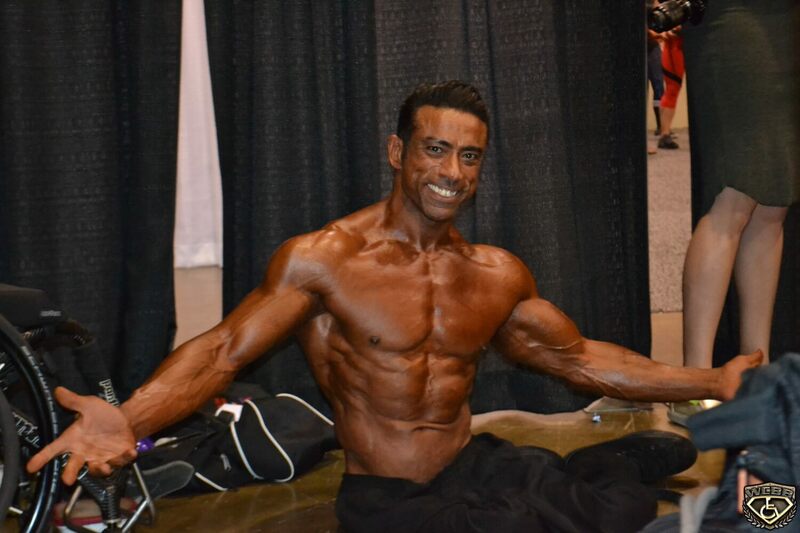 He maintains a very disciplined regimen to keep up his bodybuilding lifestyle and to help him meet his goals. 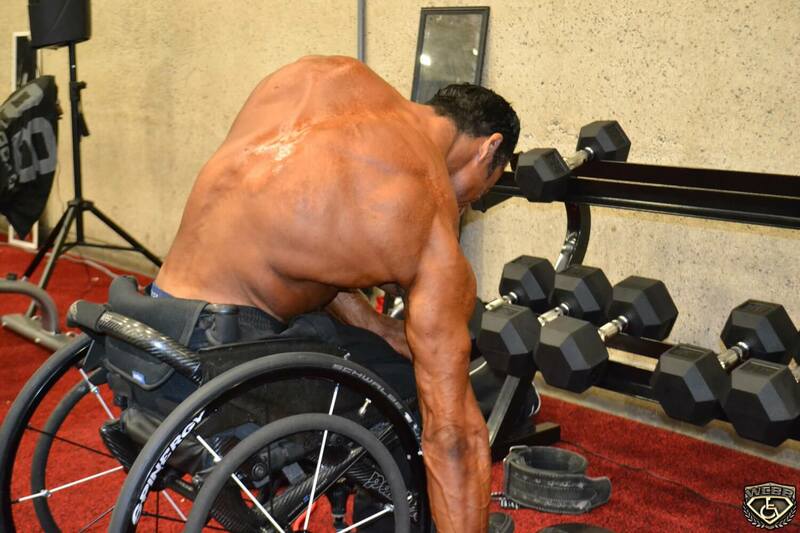 His workout routine is rigorous and very driven. 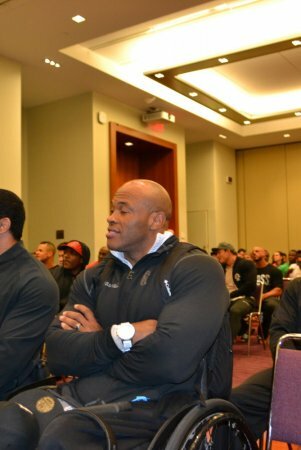 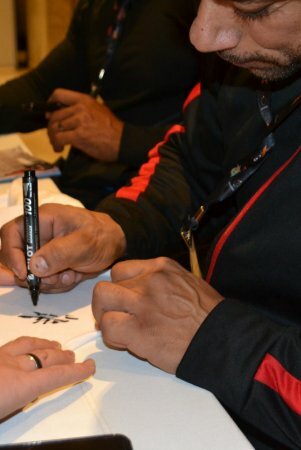 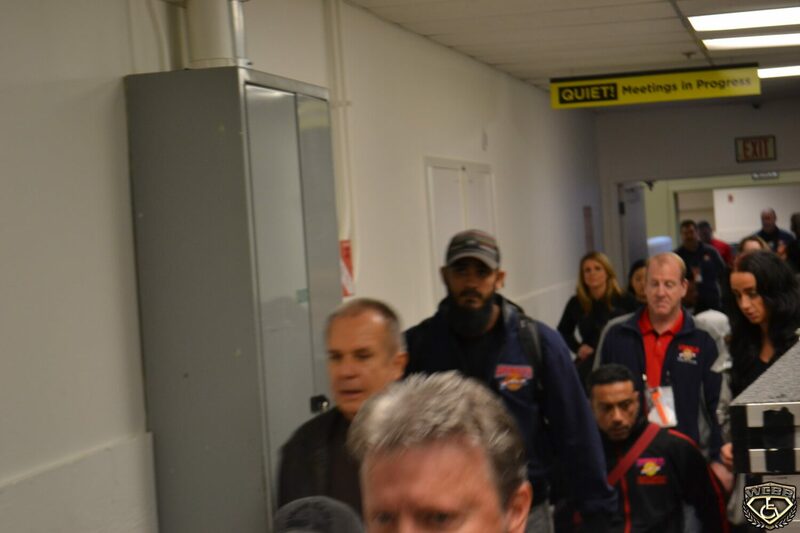 He is totally committed to doing his very best at all times both during competition and during the offseason as well. 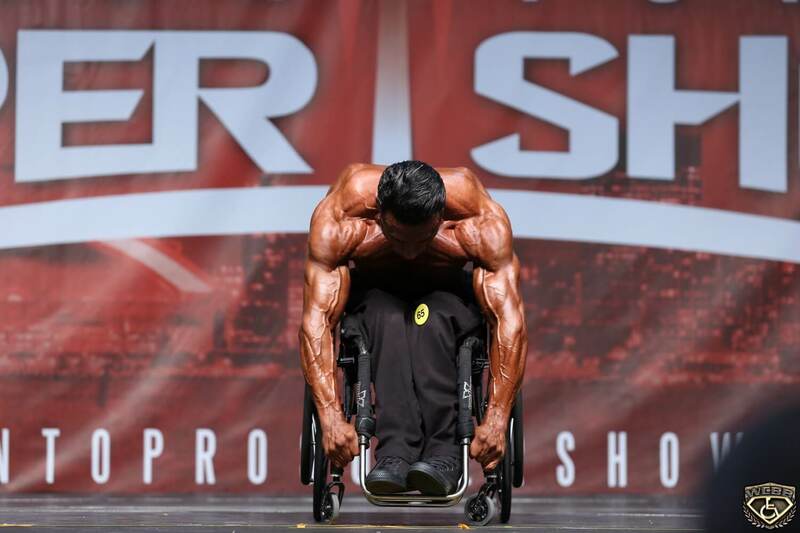 Whether it is off season or competition time he remains dedicated to his goals. 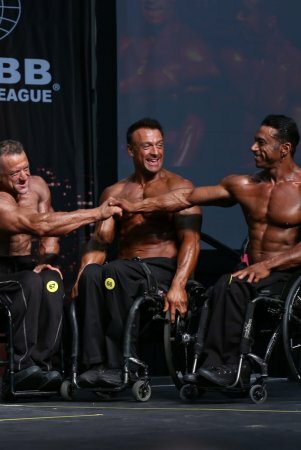 When advising others Antoni suggests that each person simply stays beautiful for themselves and do not train for others. 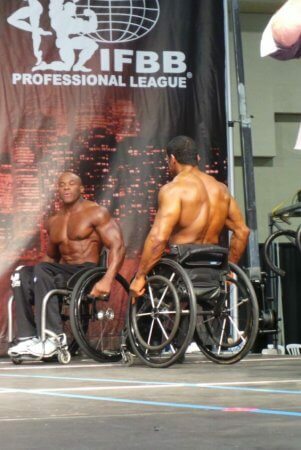 One should be their own person and their training should be for them not for others. 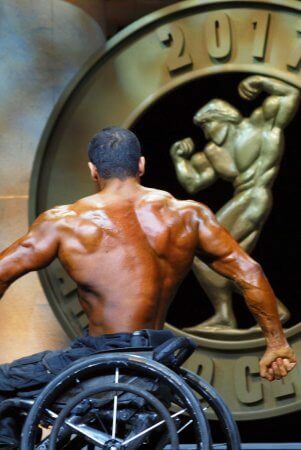 One should also be their own person and do what is right for them. 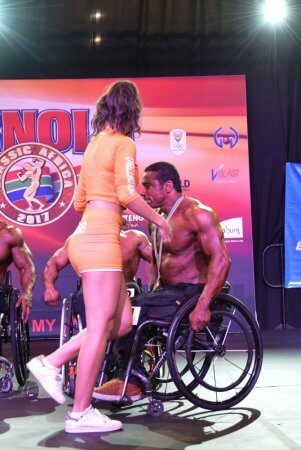 He advises also that one should not be a show-off and that they should not try to be stronger than others that are competing. 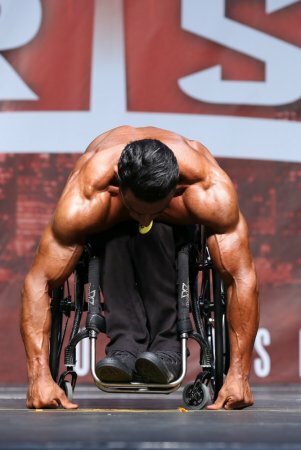 One should simply focus on themselves when trying to train. 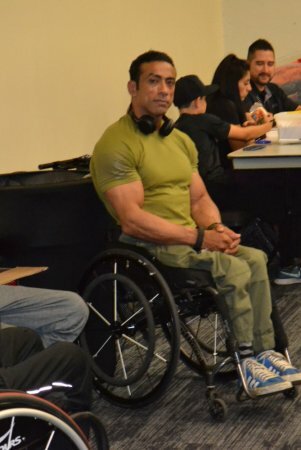 I am in a wheelchair due to an accident from the war. 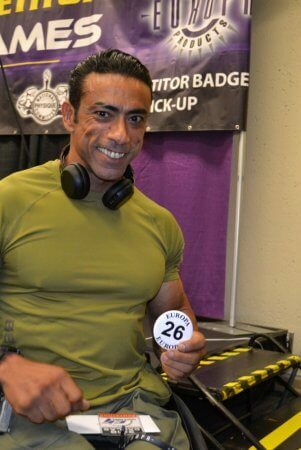 In 1987 I enlisted in the Army at the young aged of 17. In 1990 I was involved in a war fight along with 200 other soldiers and I was seriously injured. 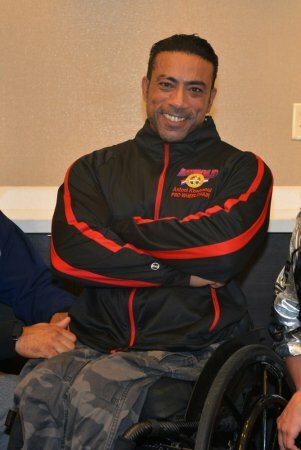 I woke up in the hospital and was told by the doctors that I had suffered an injury to the T12 in my spine which left me with permanent spinal cord injuries. 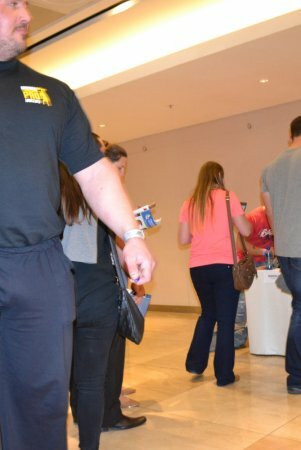 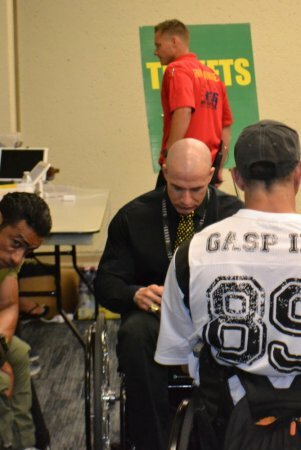 Those injuries caused me to have no feelings in my legs. 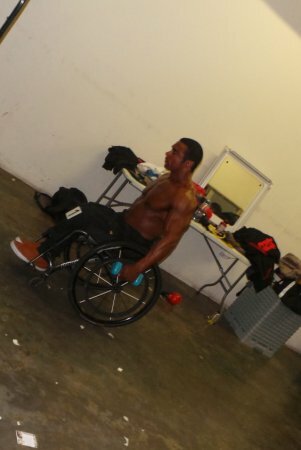 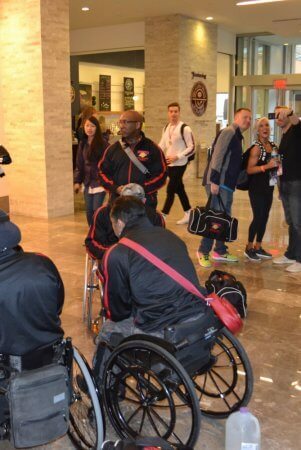 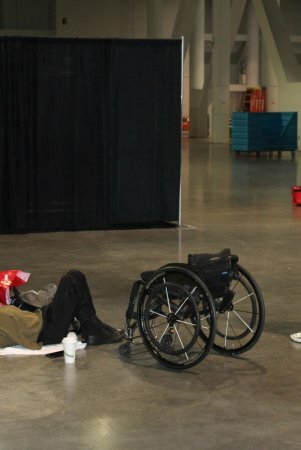 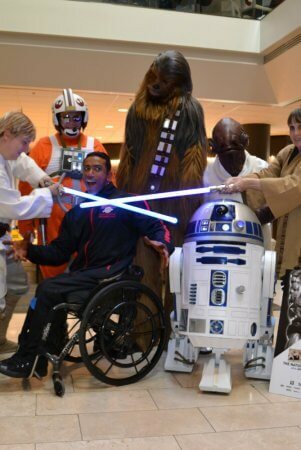 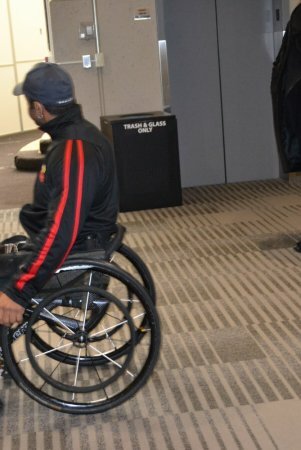 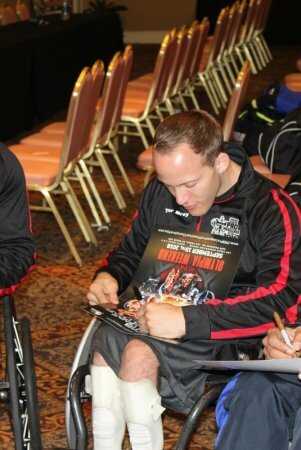 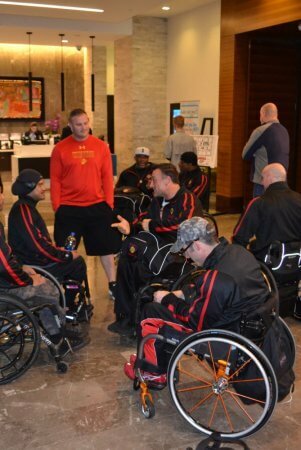 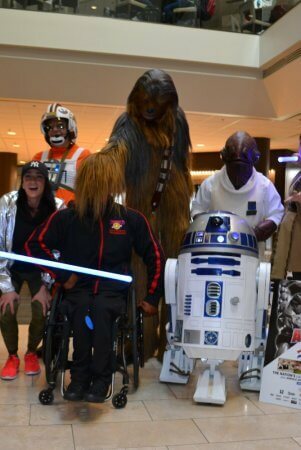 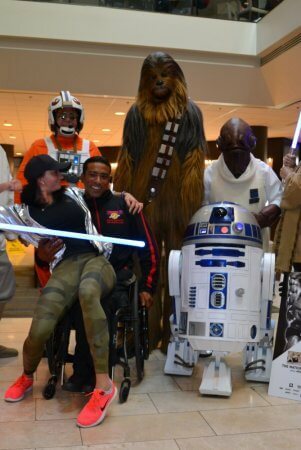 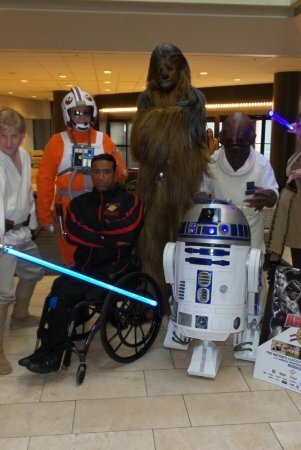 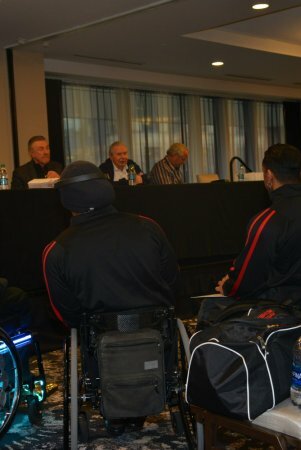 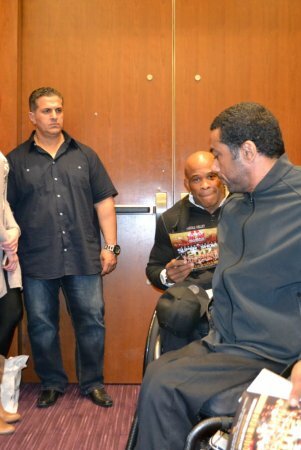 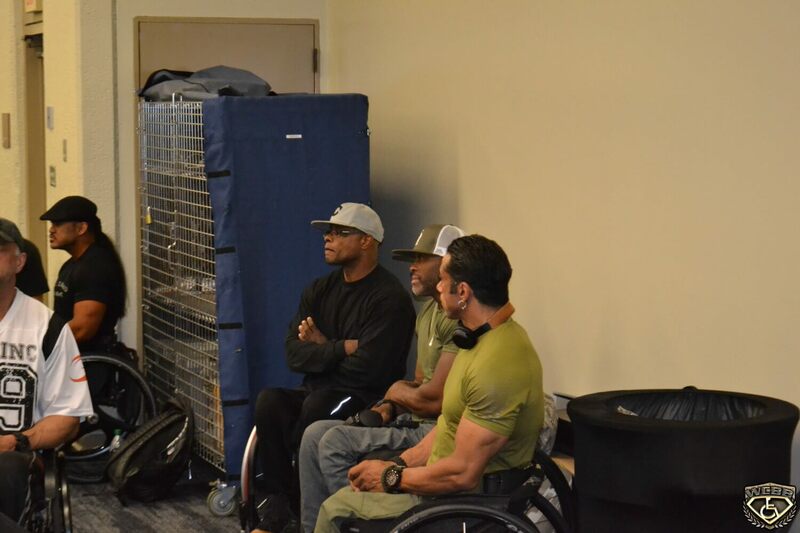 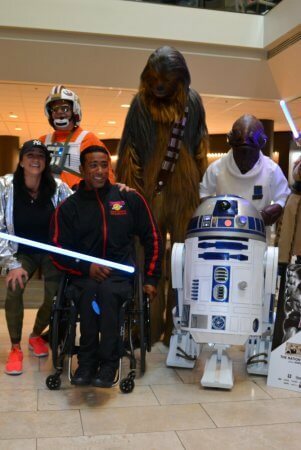 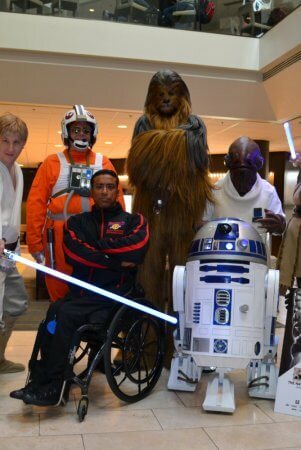 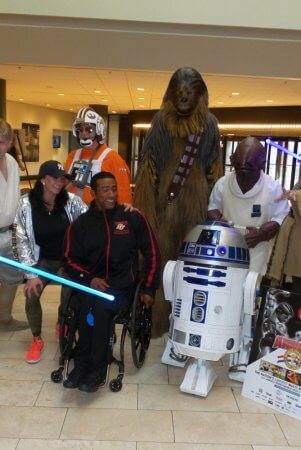 I have been in a wheelchair since the injury. 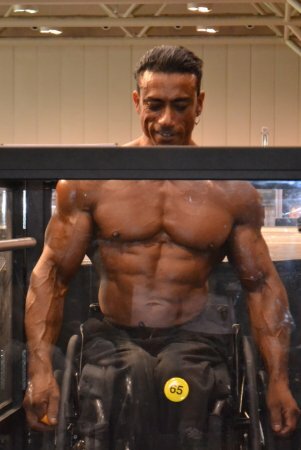 I started doing bench pressing for myself after being released from the hospital in hopes of building and strengthening my upper body. 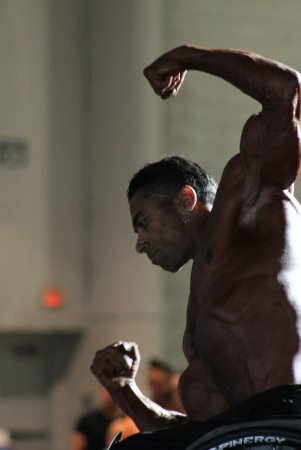 I focused mainly on my biceps as that was my favorite muscles to work on and define. In 1992 I was approached by a promoter who ask me if I would be interested in doing a bodybuilding show for over 5000 people. 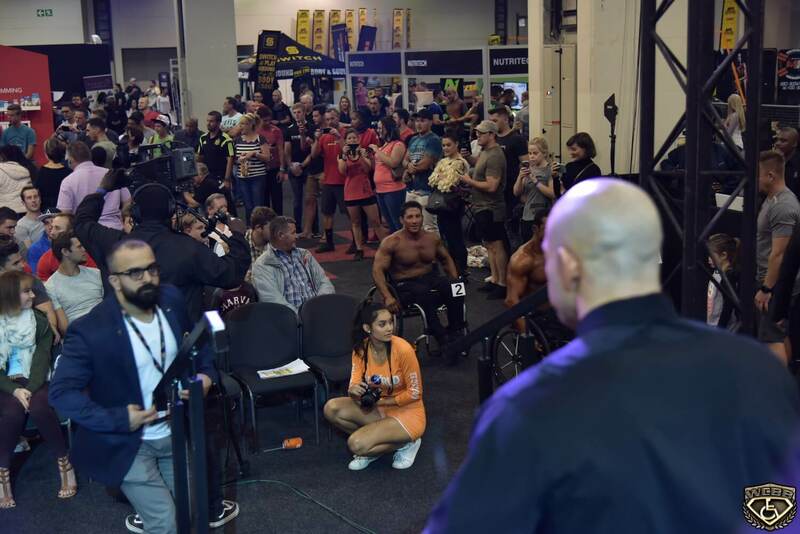 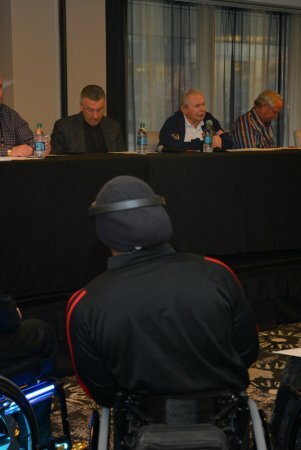 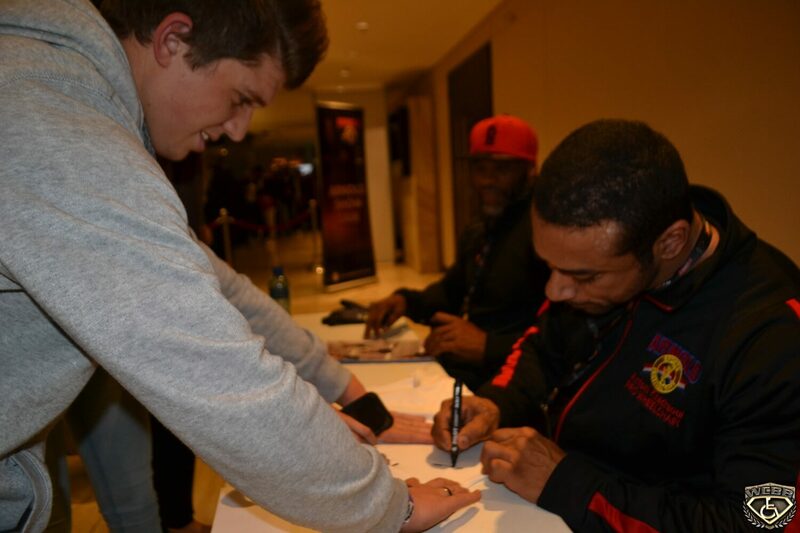 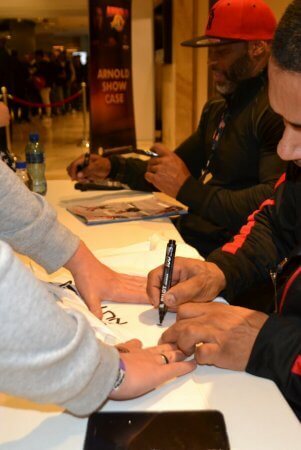 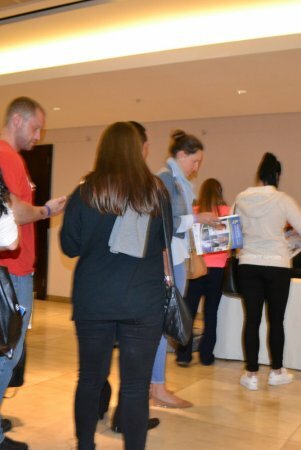 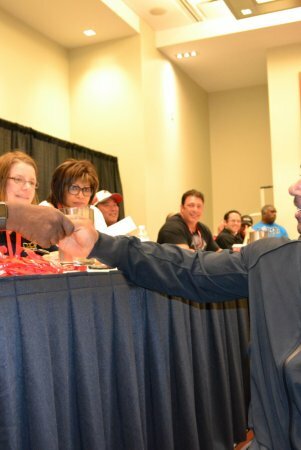 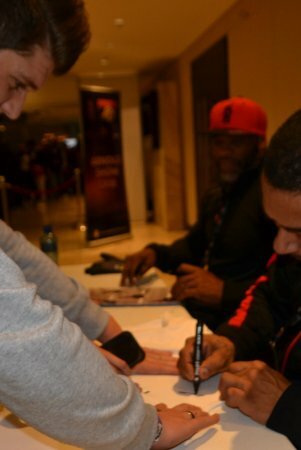 I did the show and made a huge impression on the audience. 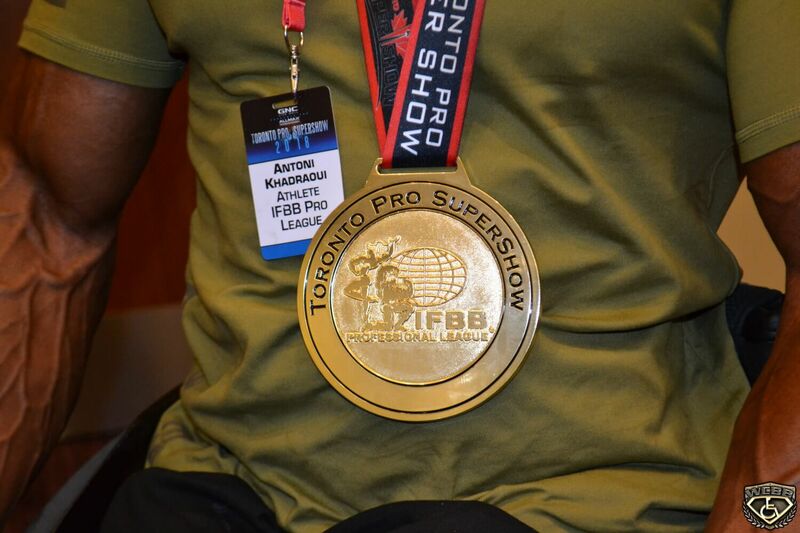 The promoter issued my a license the same day to compete in the SKKF. 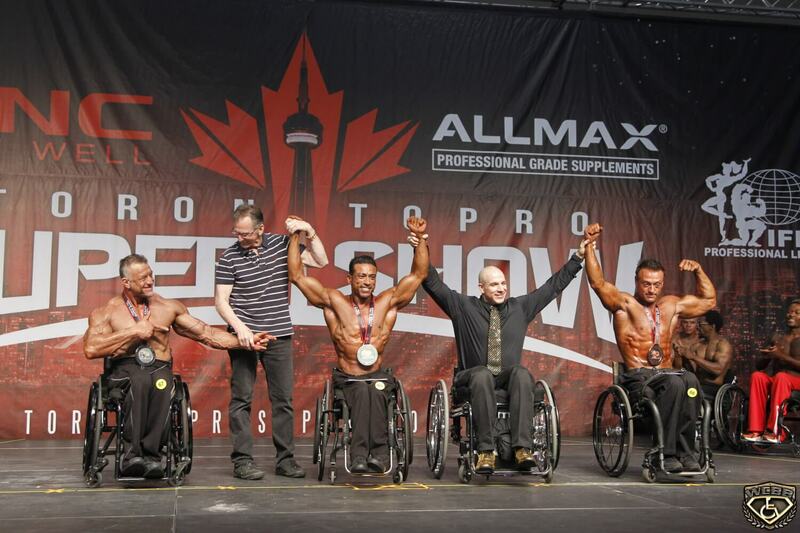 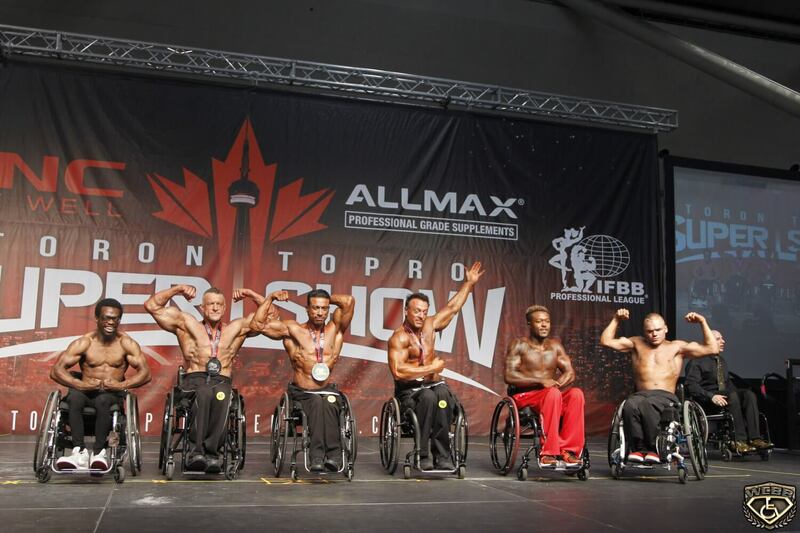 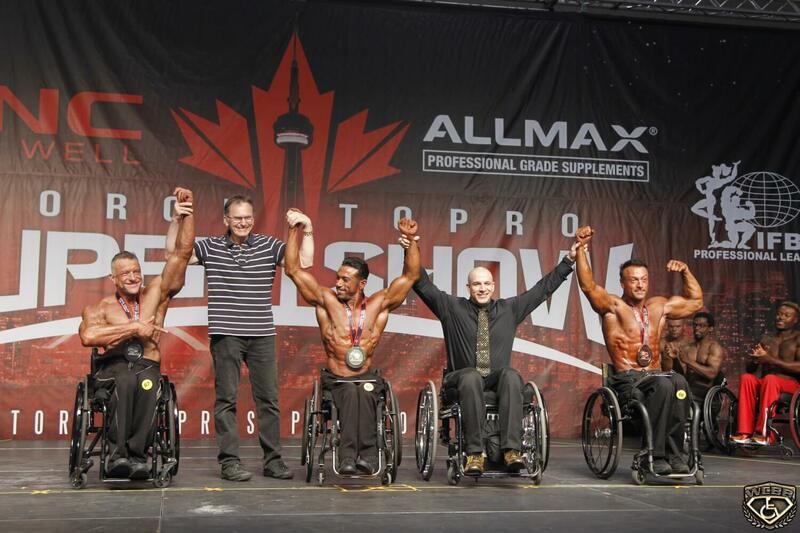 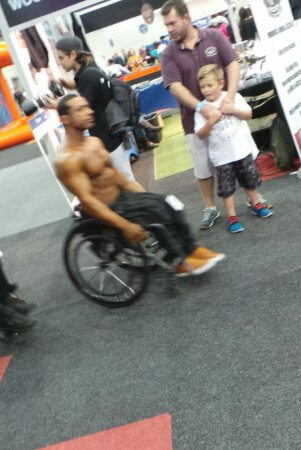 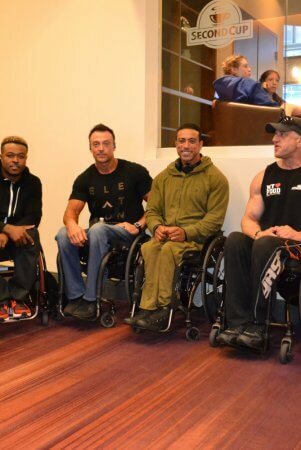 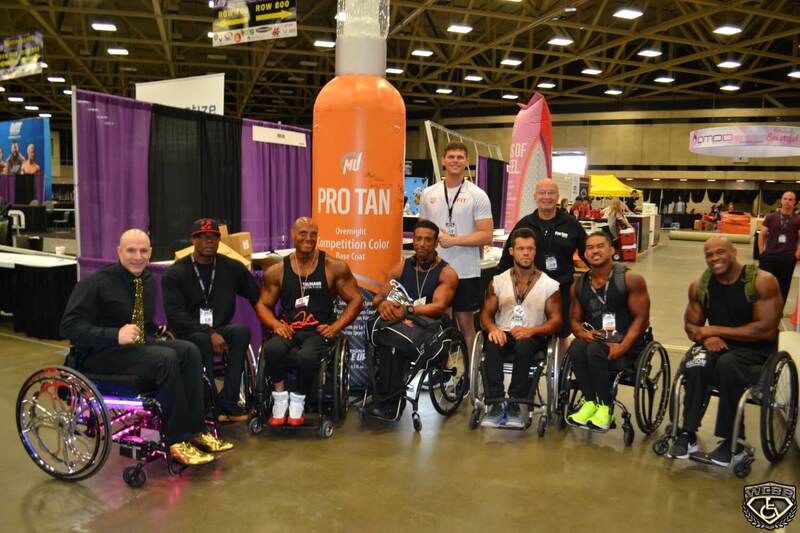 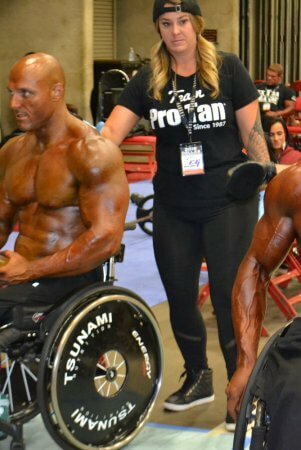 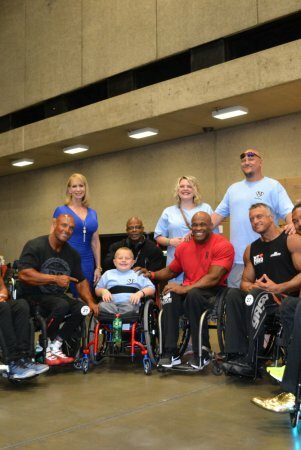 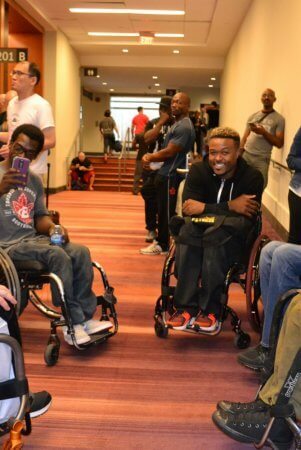 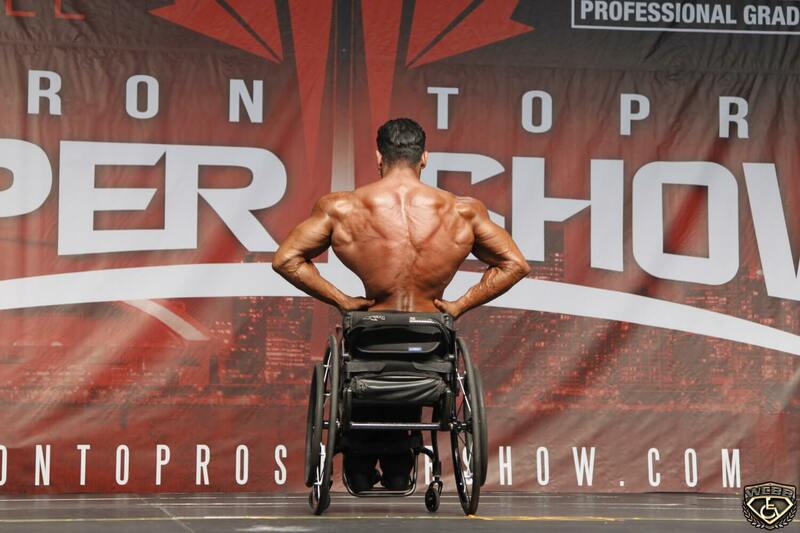 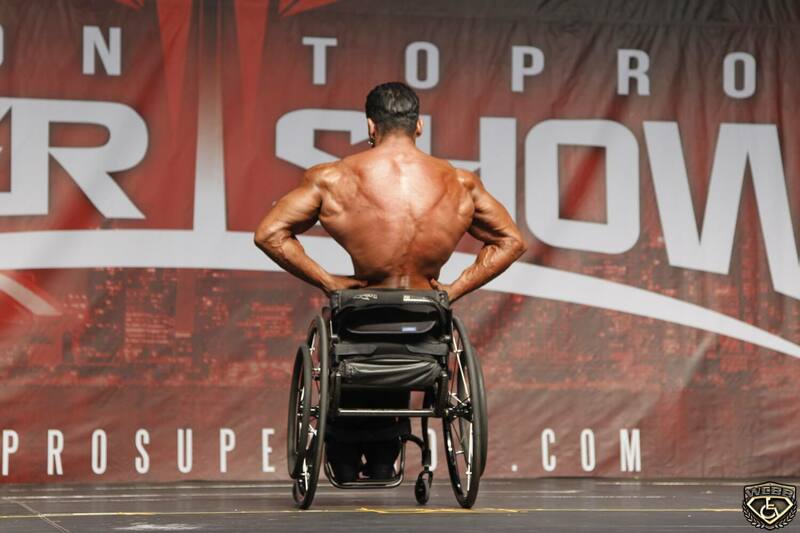 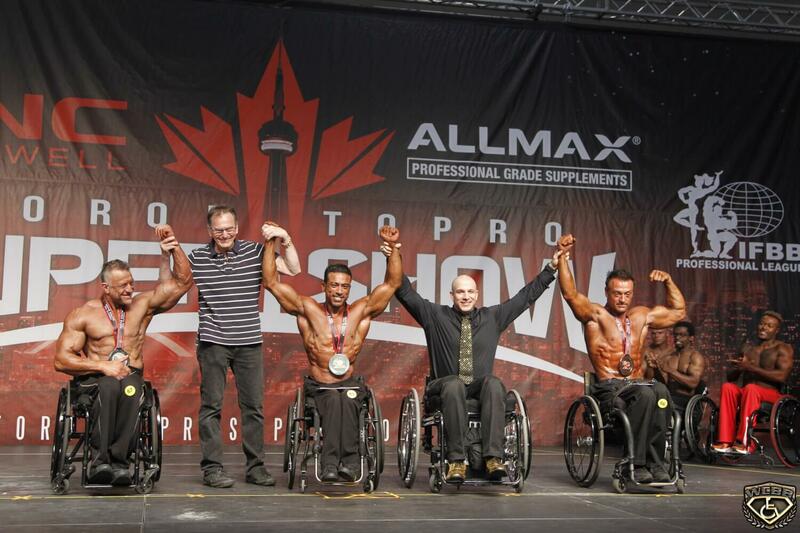 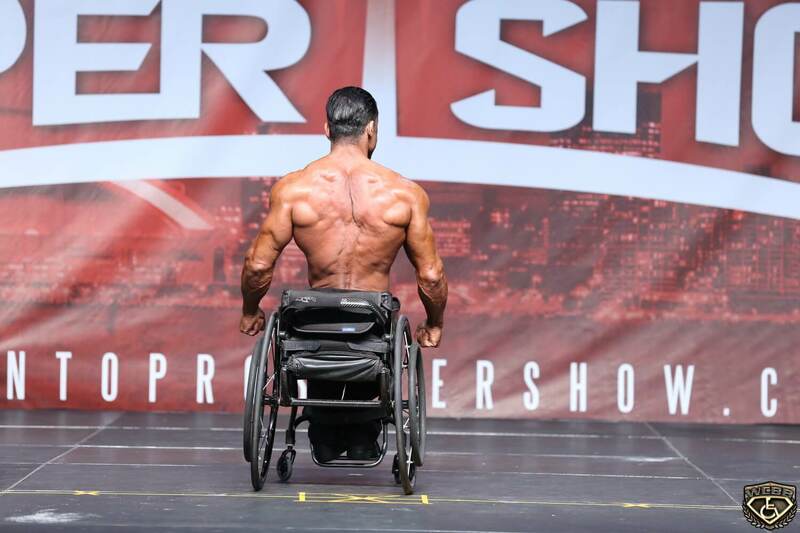 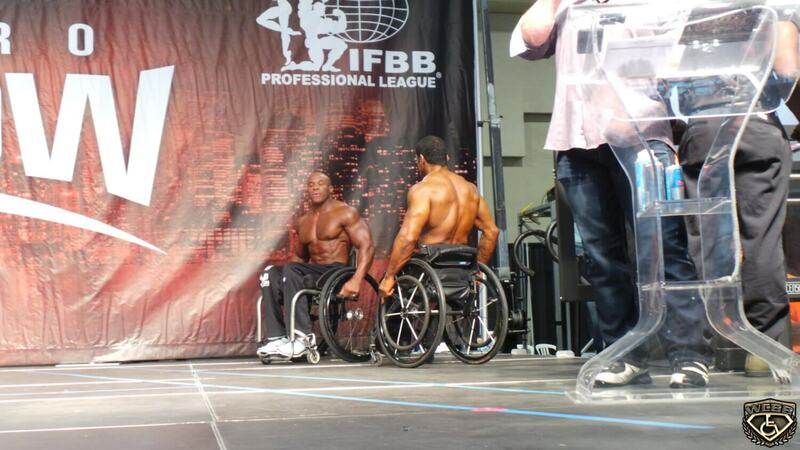 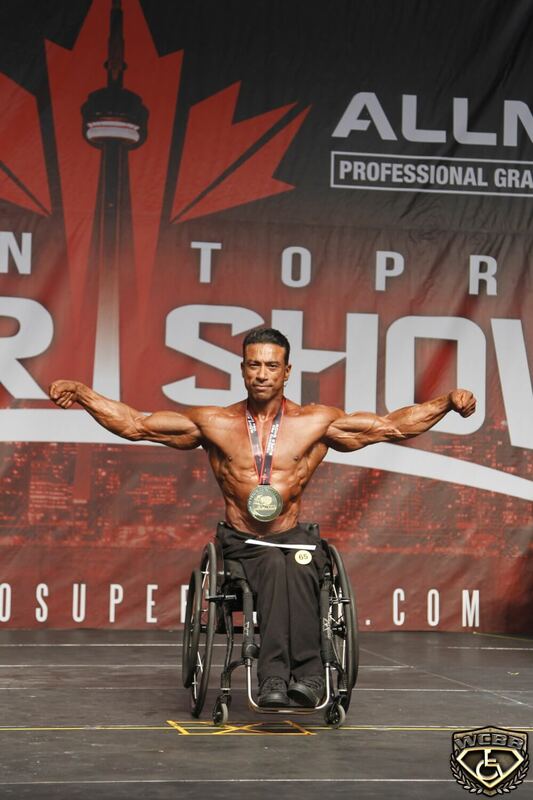 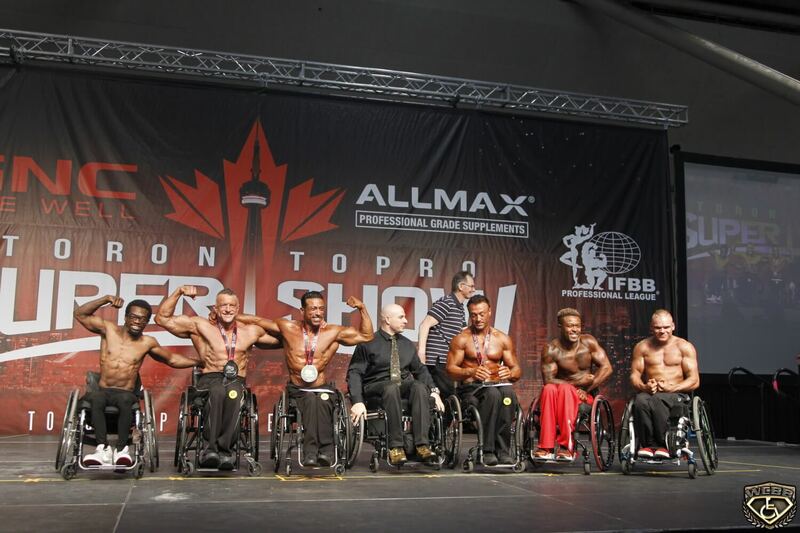 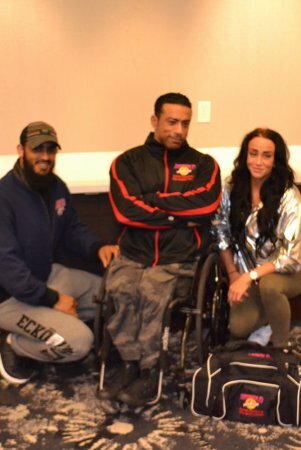 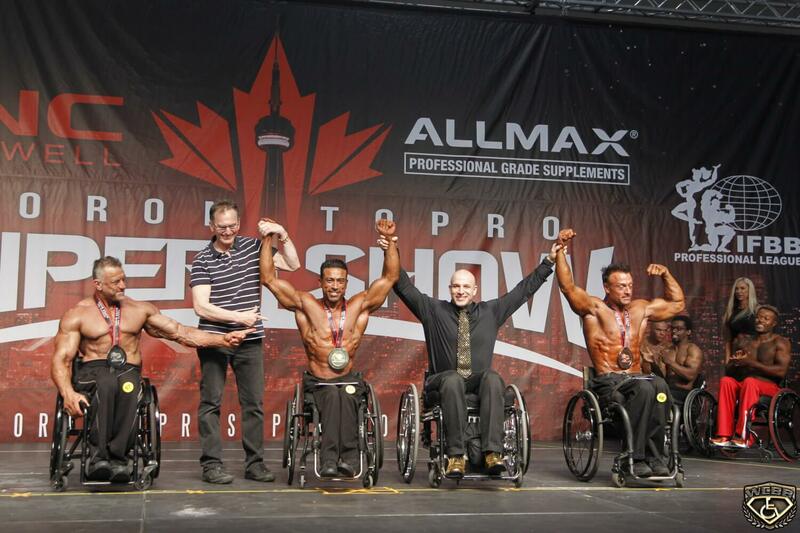 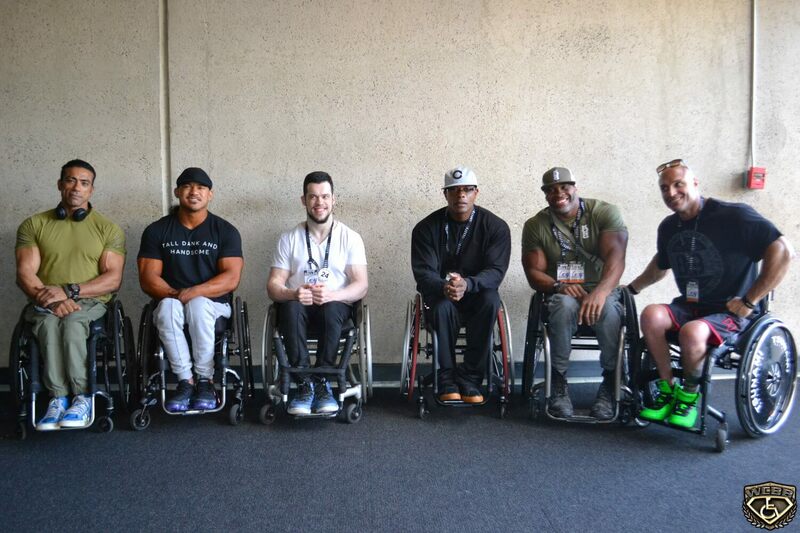 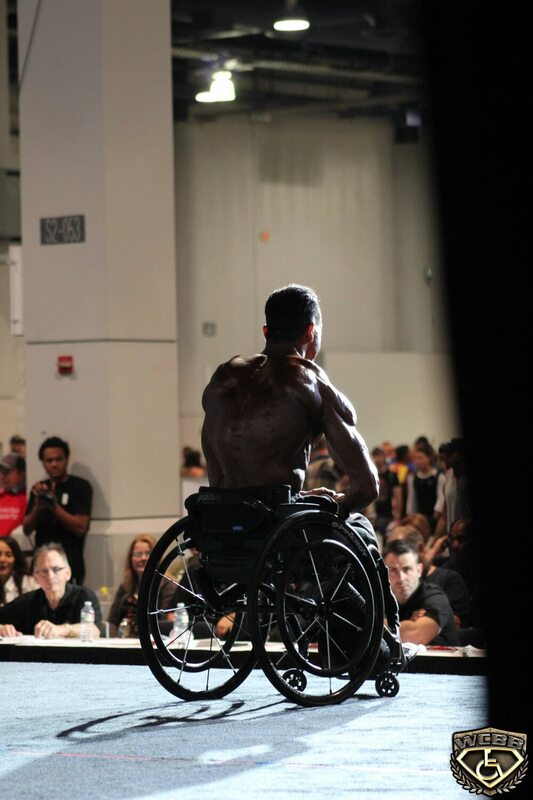 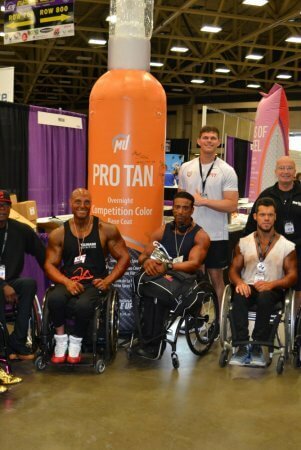 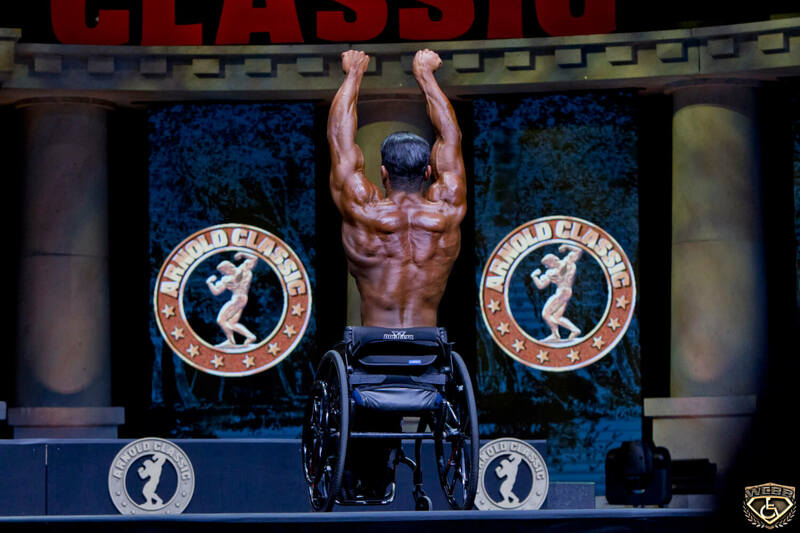 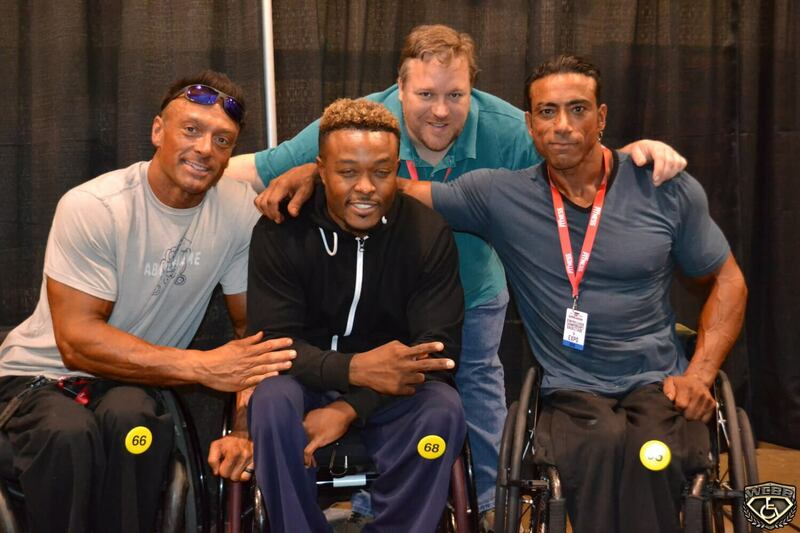 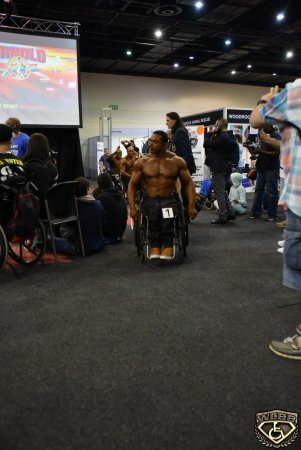 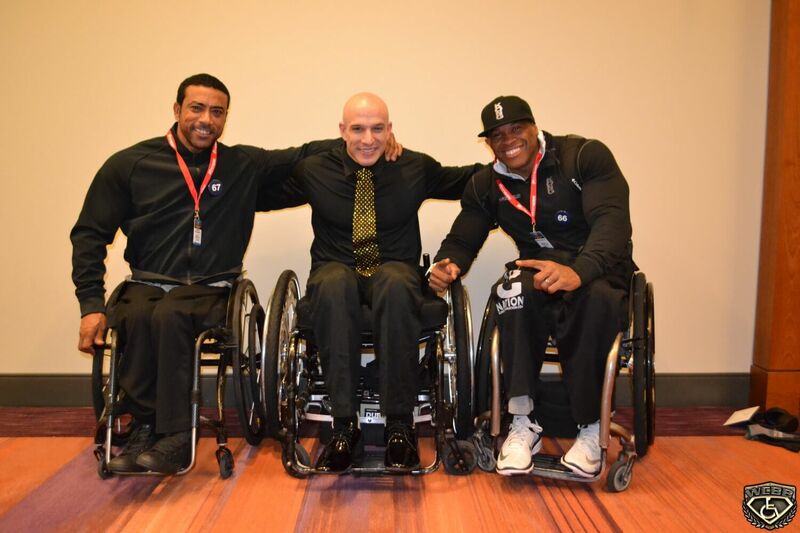 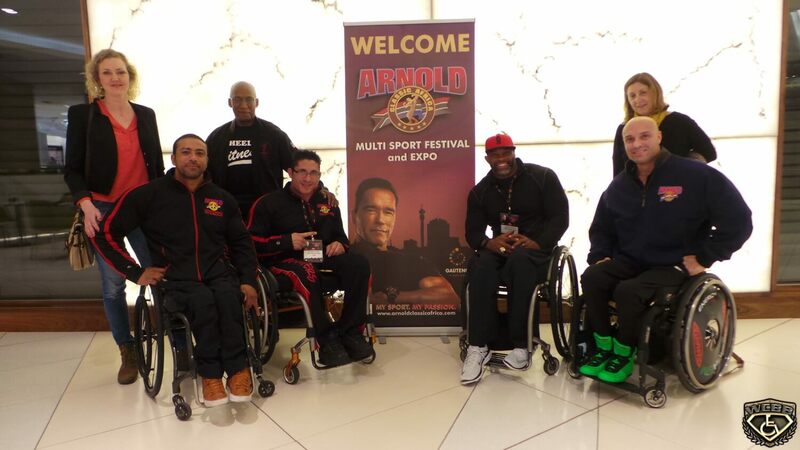 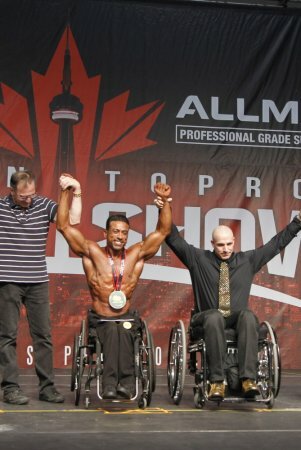 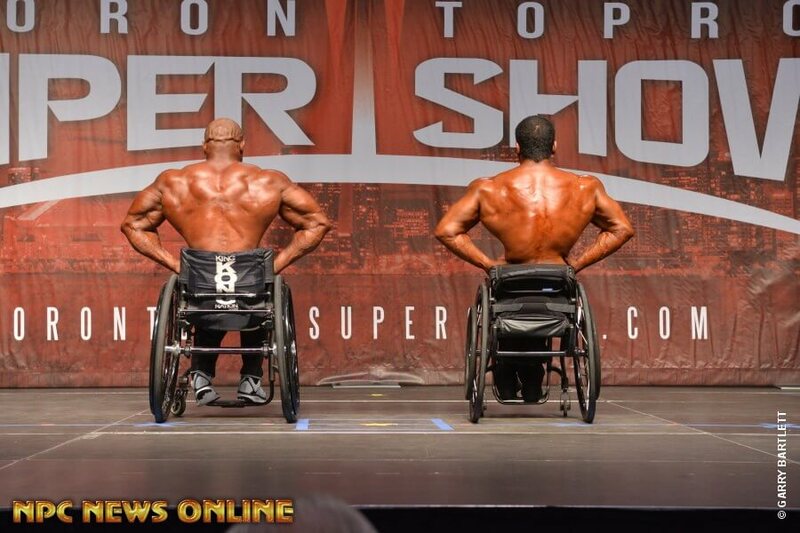 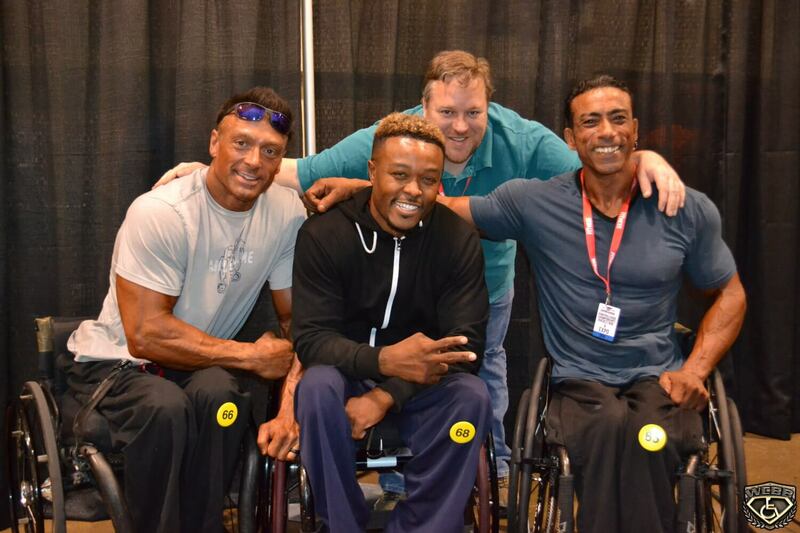 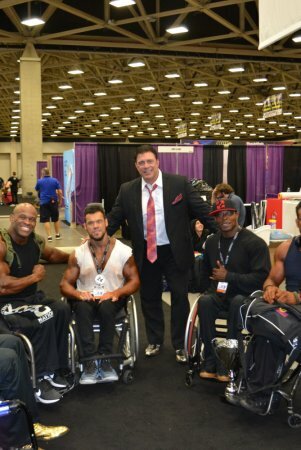 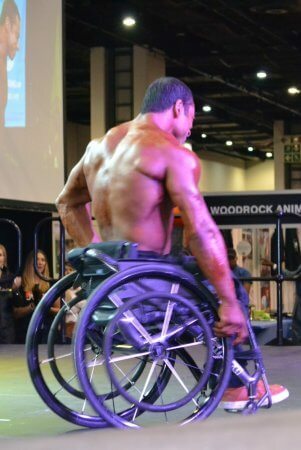 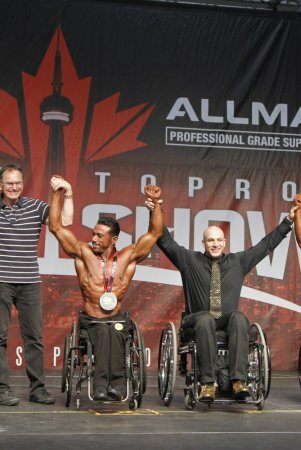 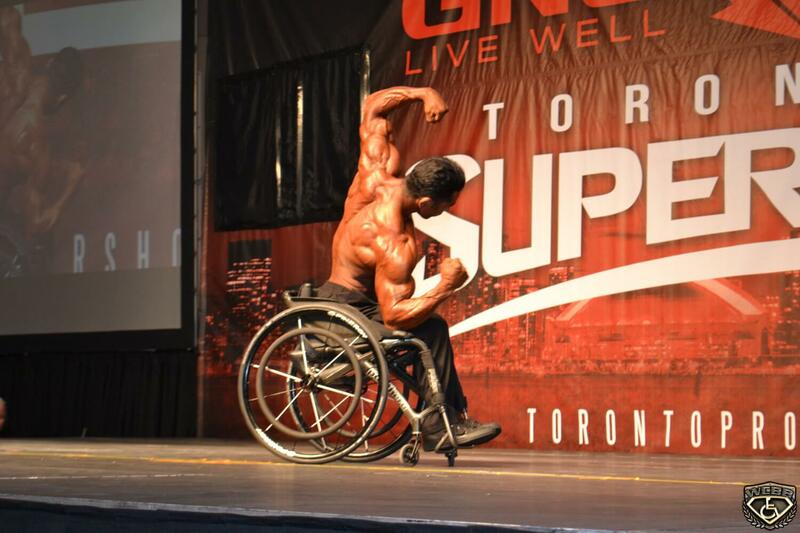 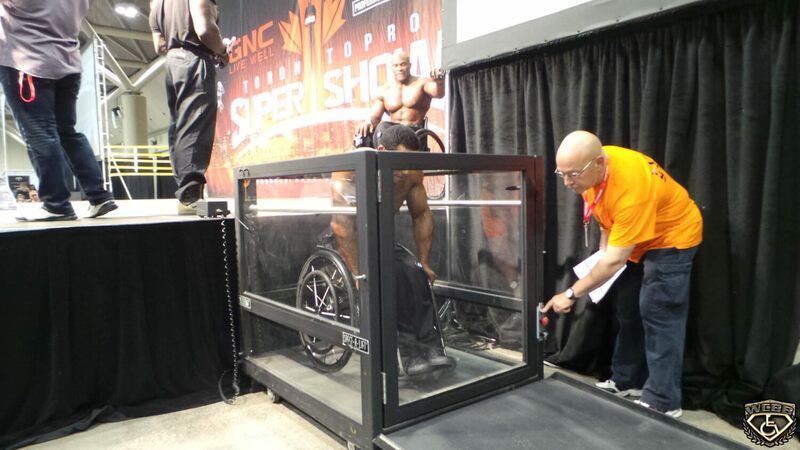 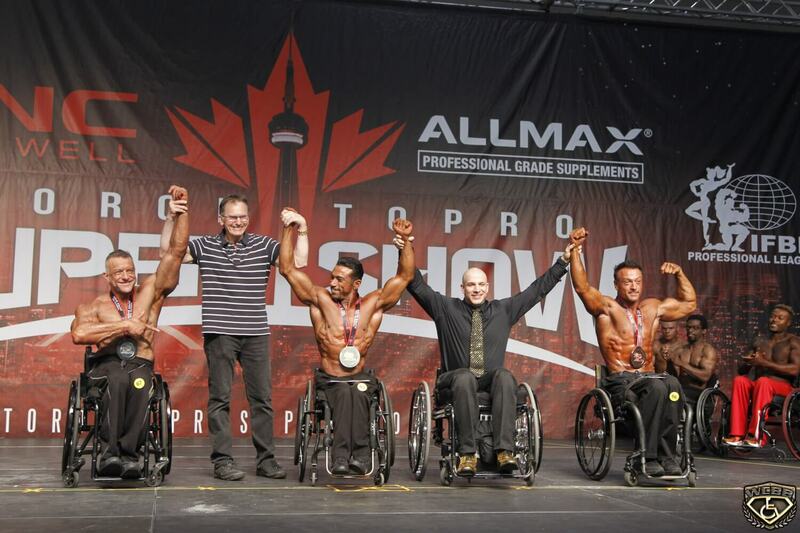 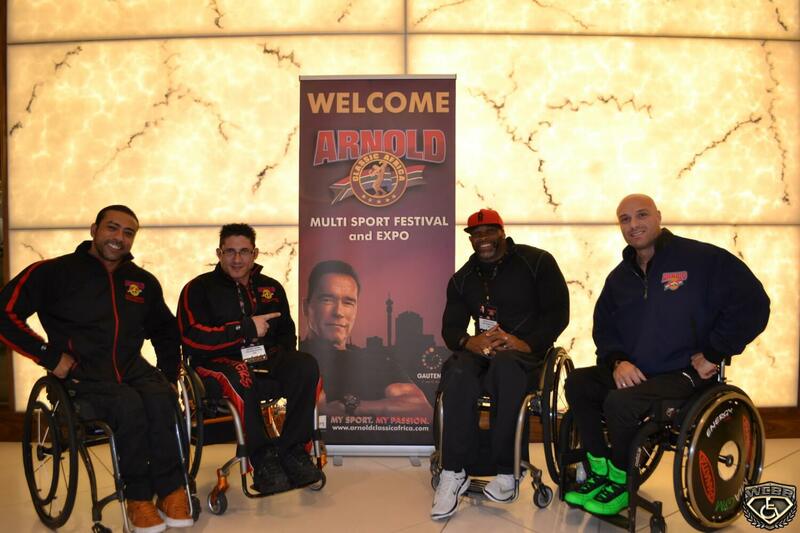 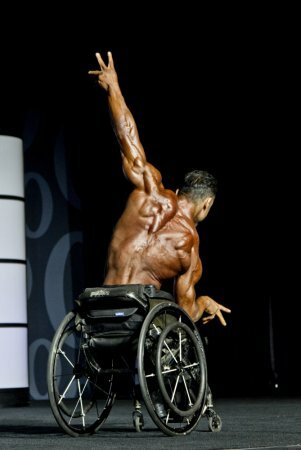 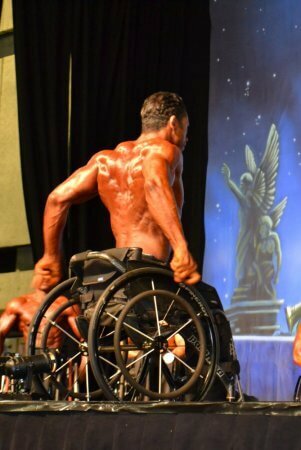 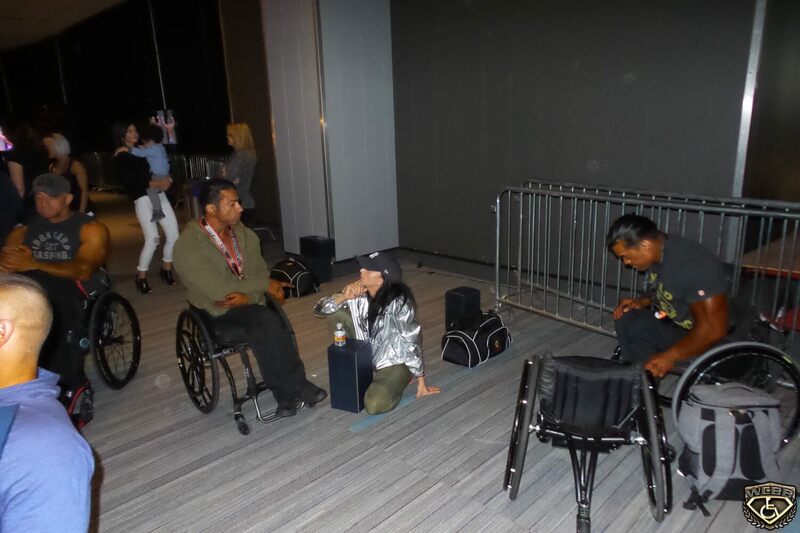 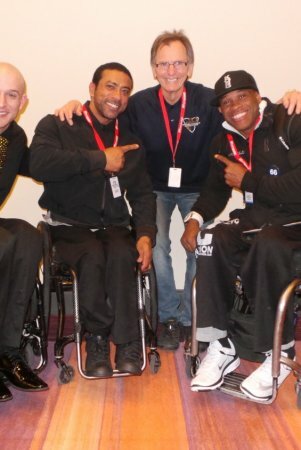 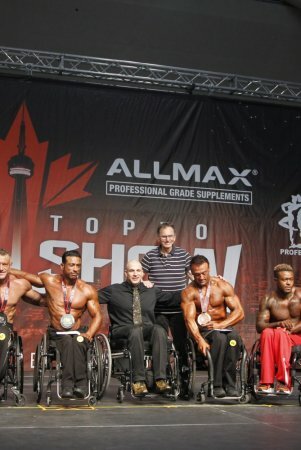 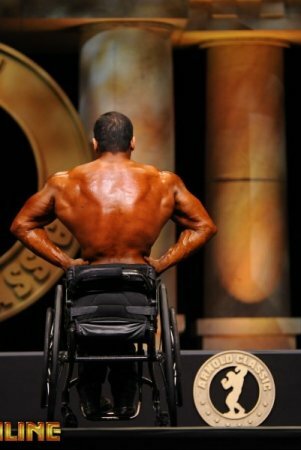 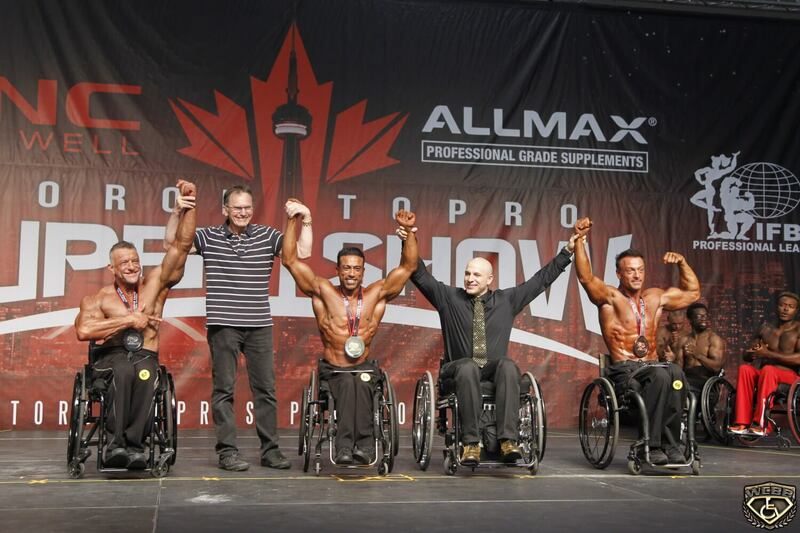 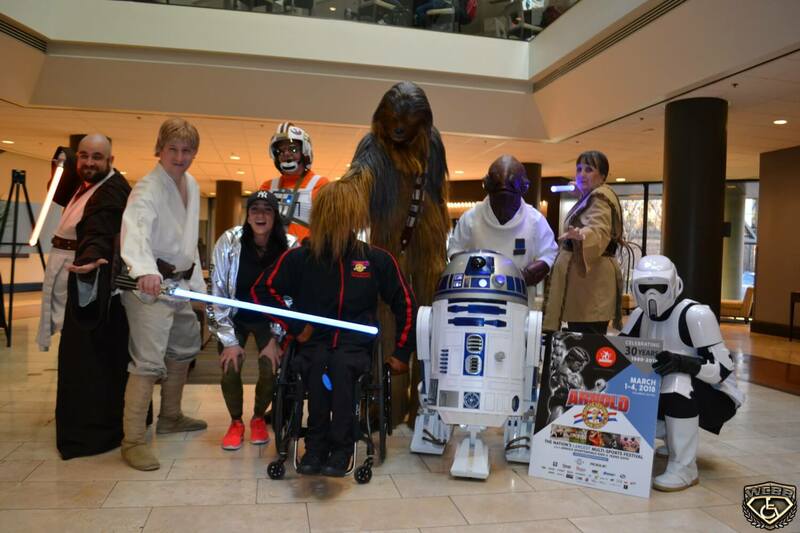 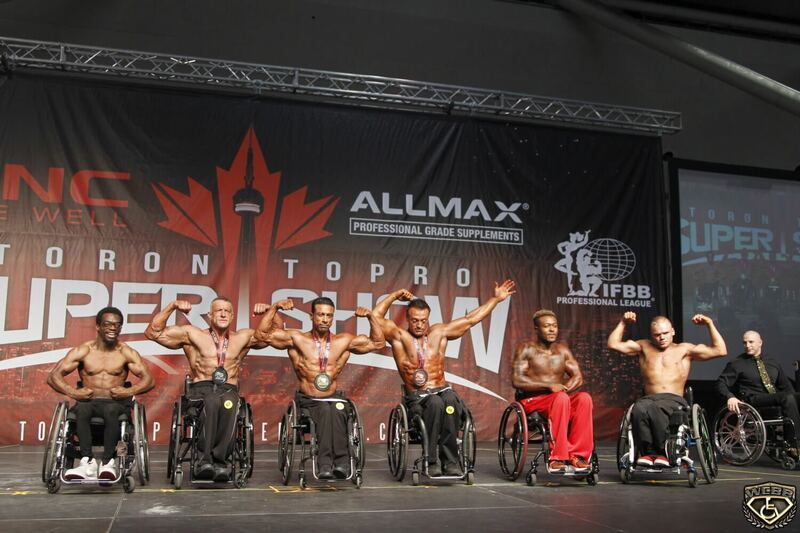 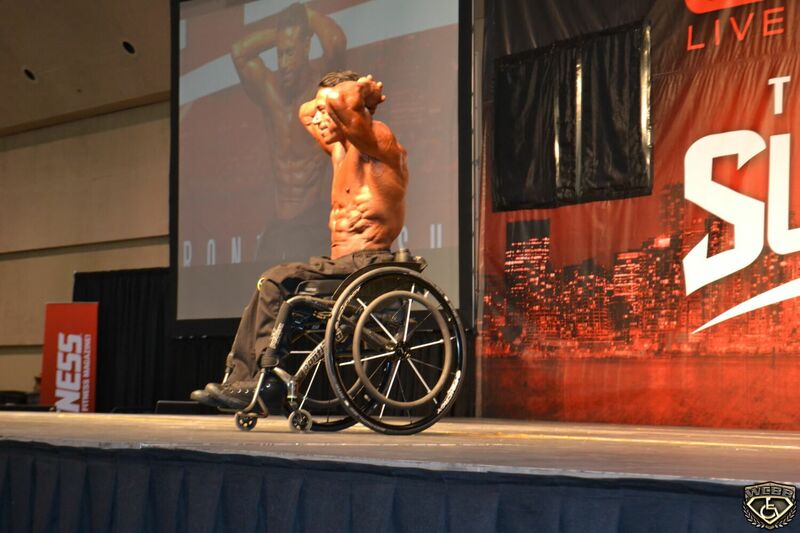 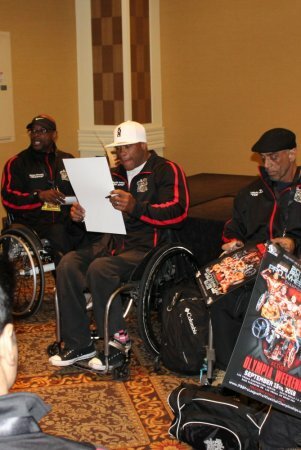 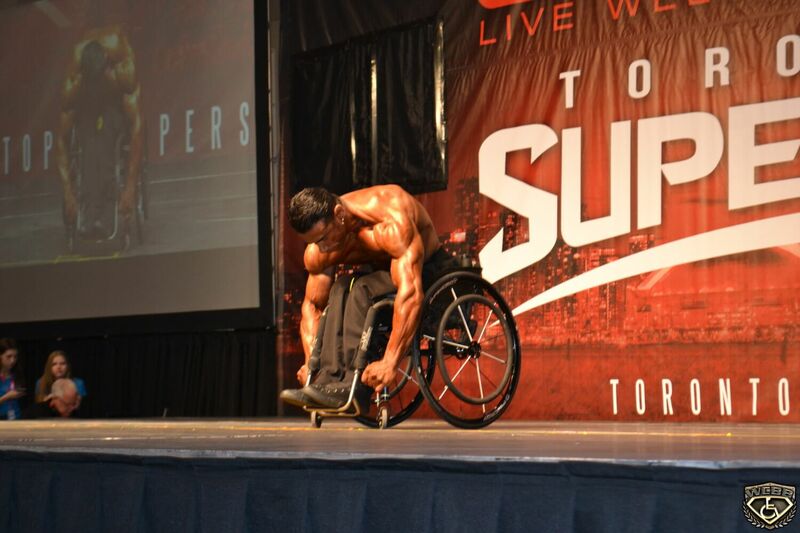 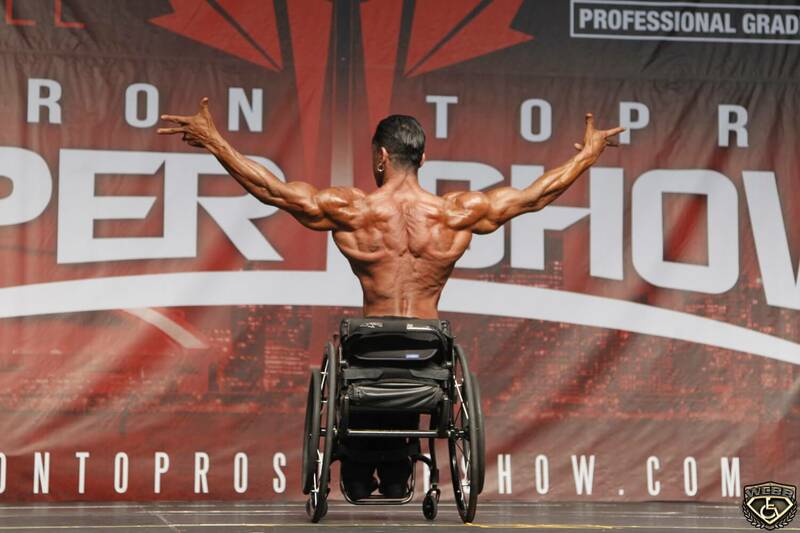 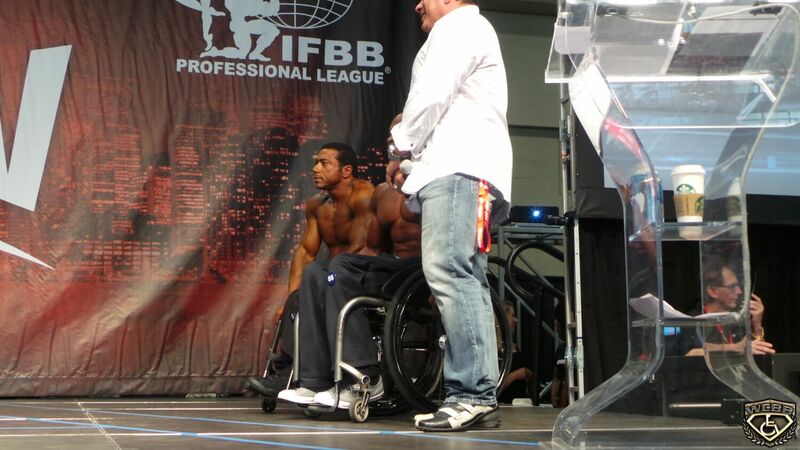 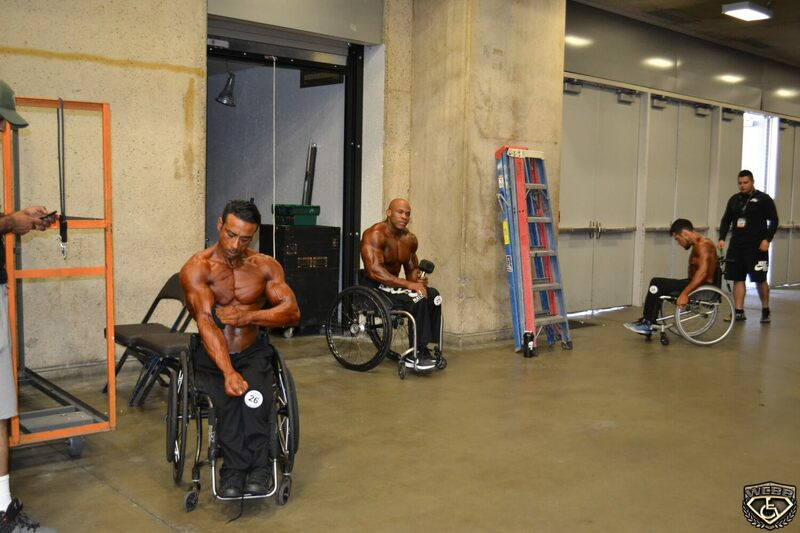 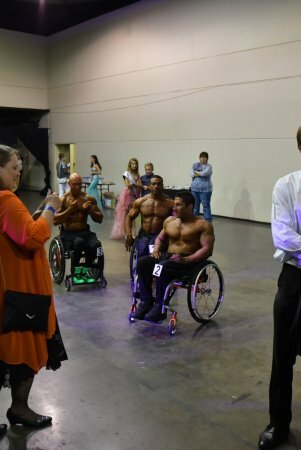 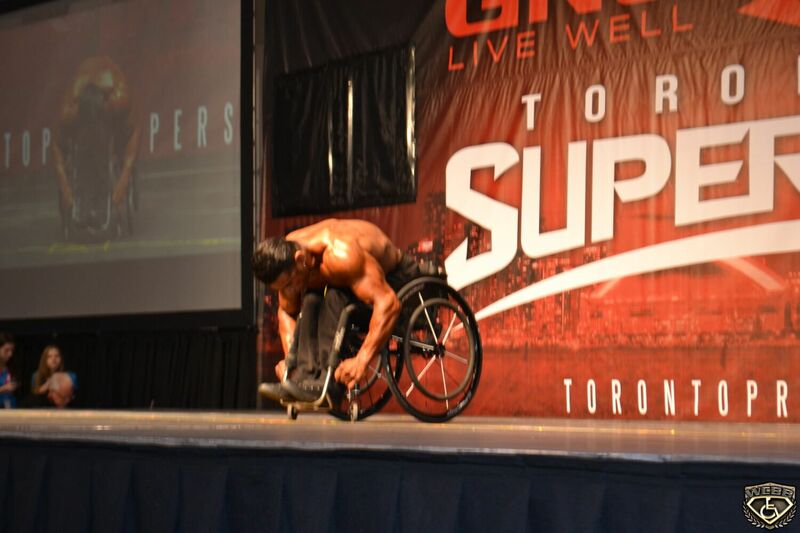 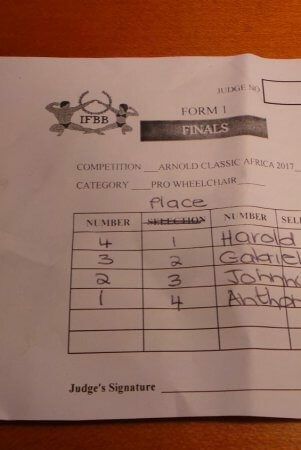 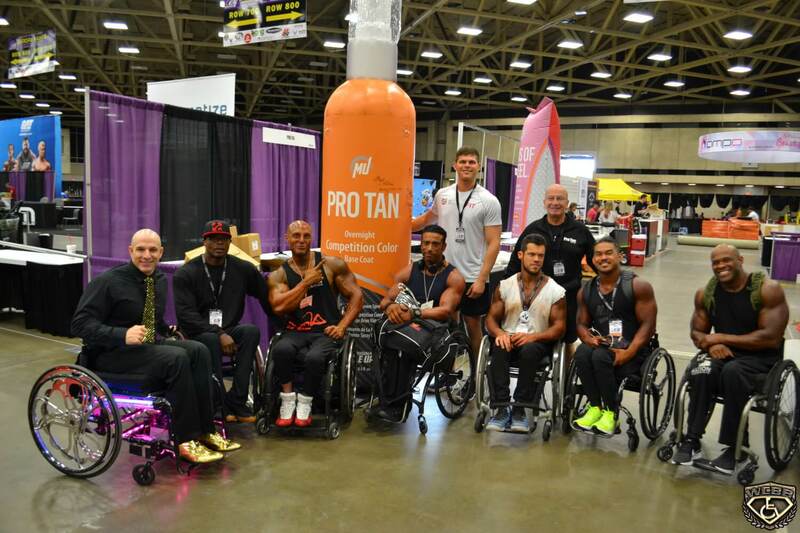 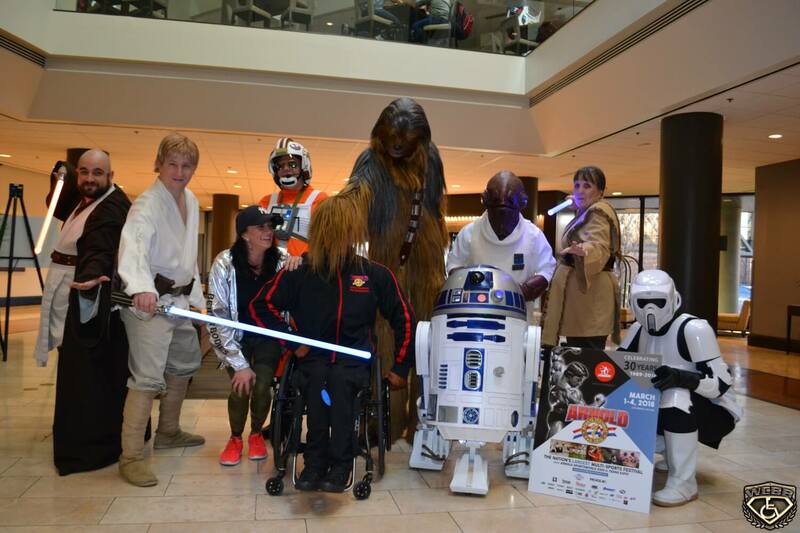 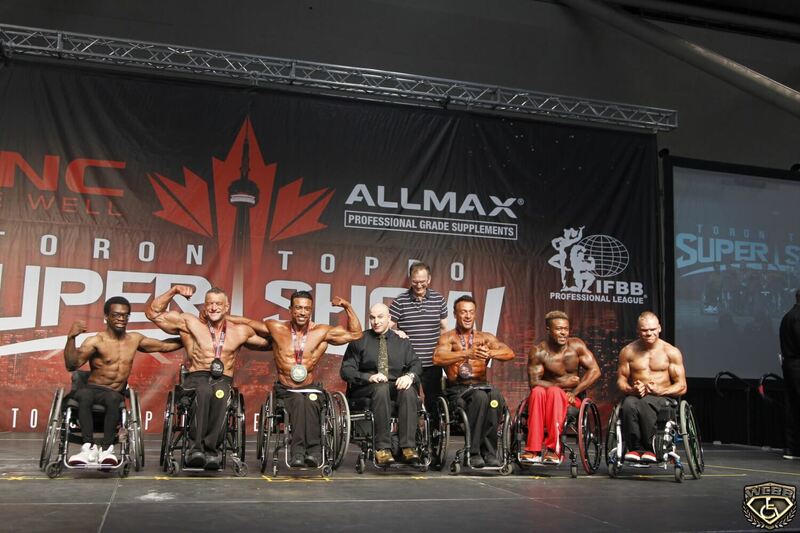 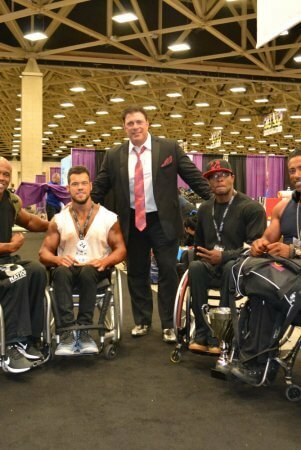 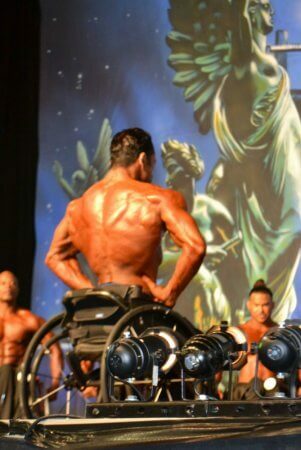 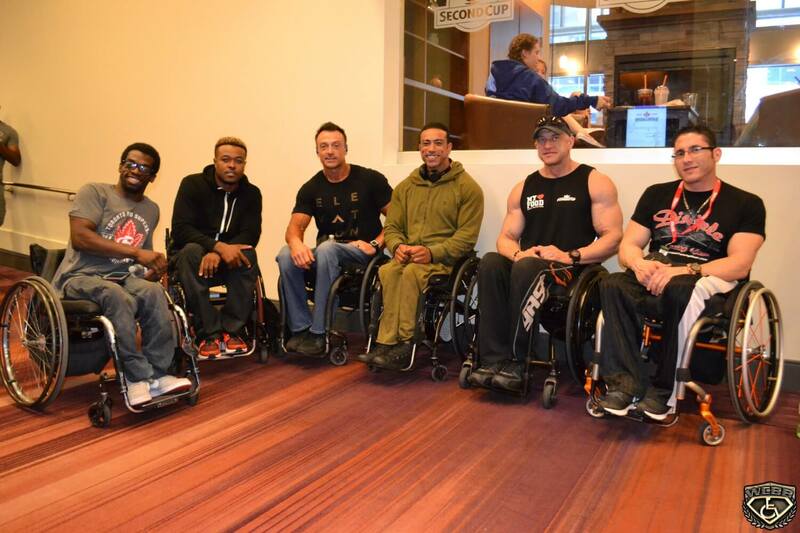 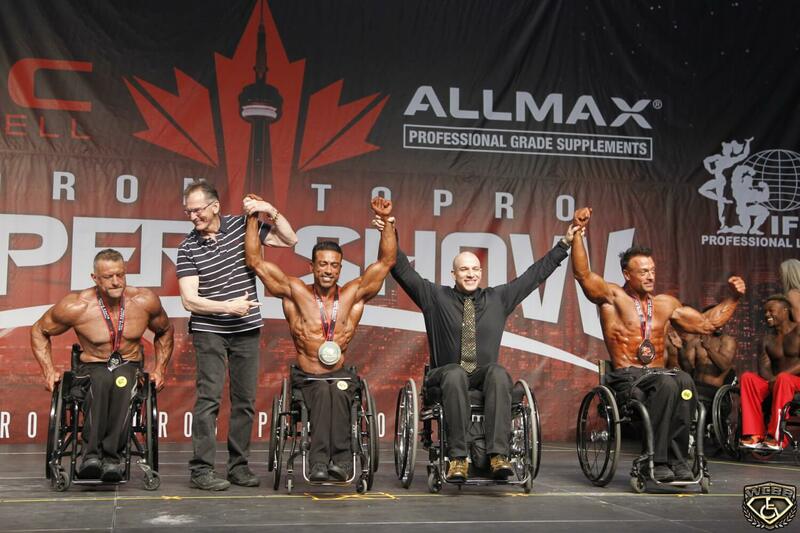 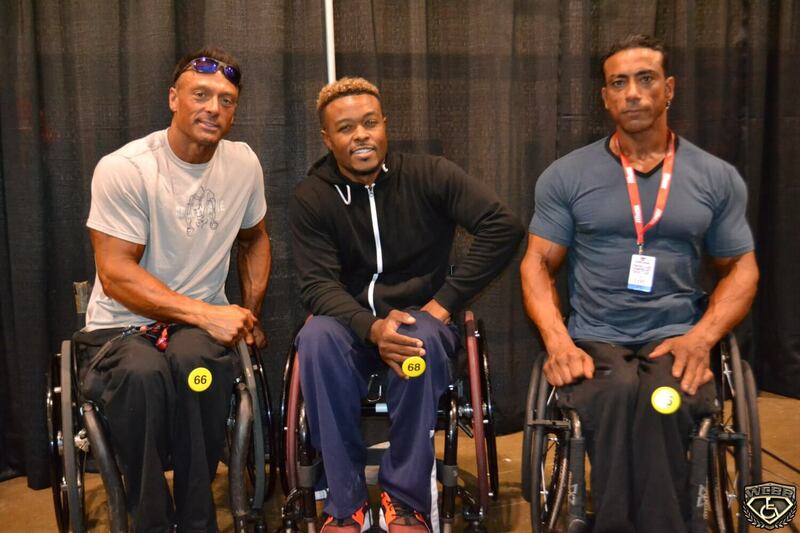 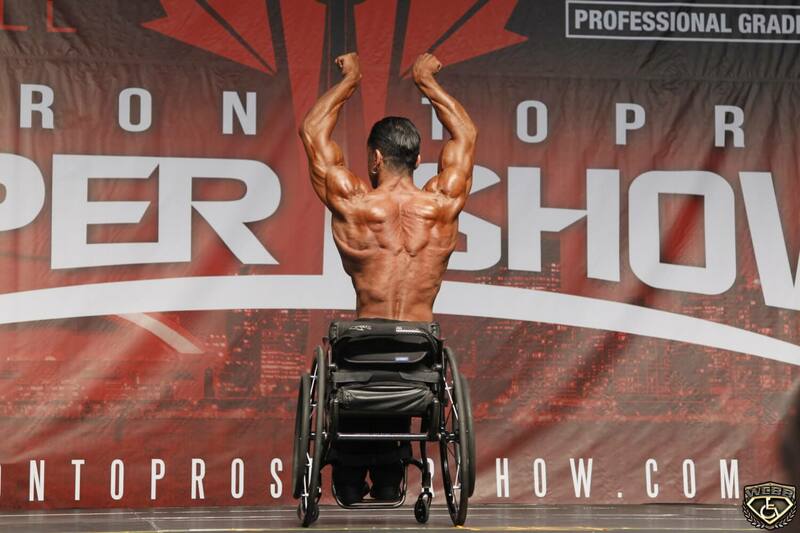 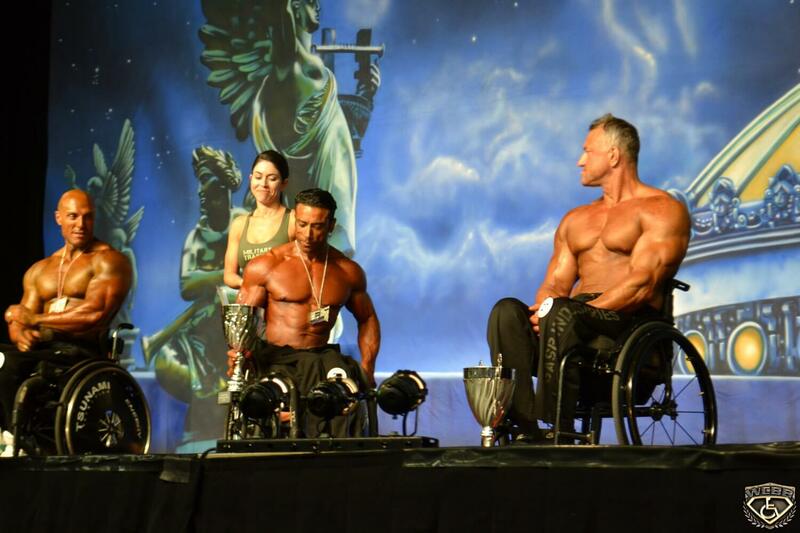 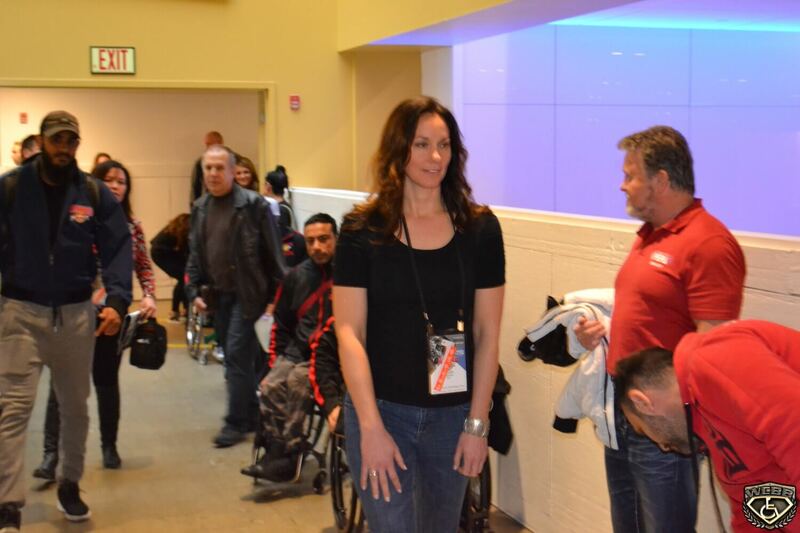 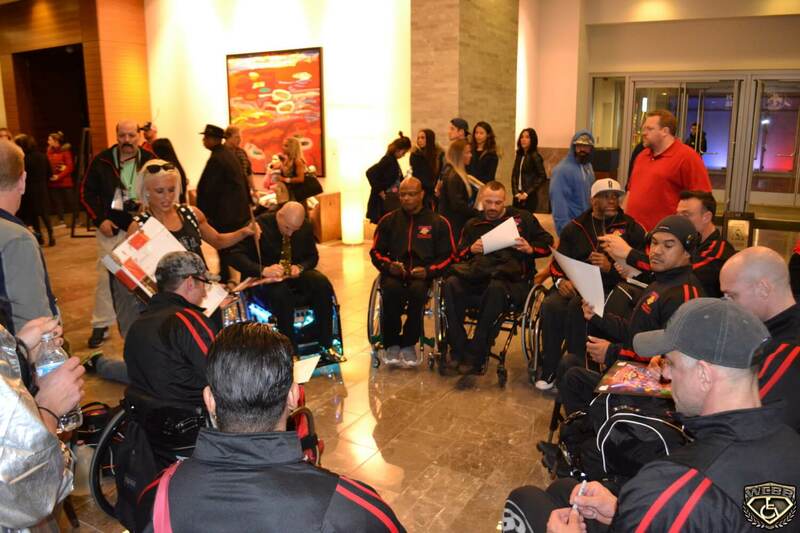 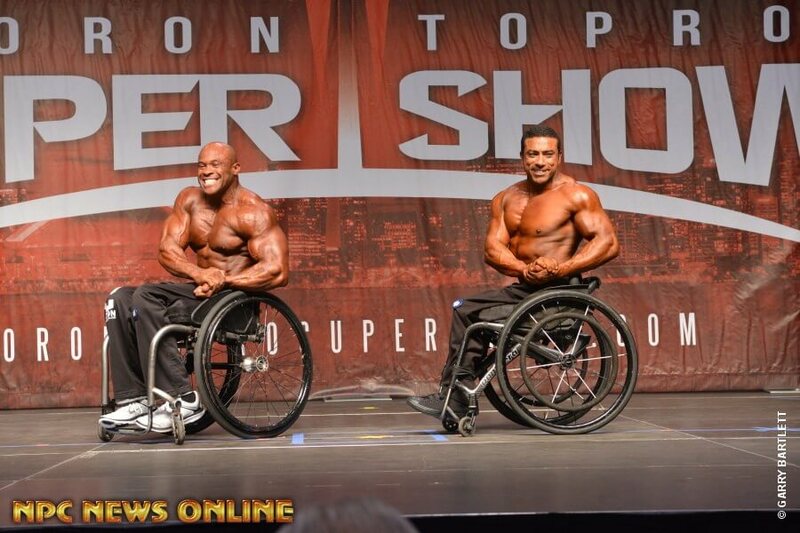 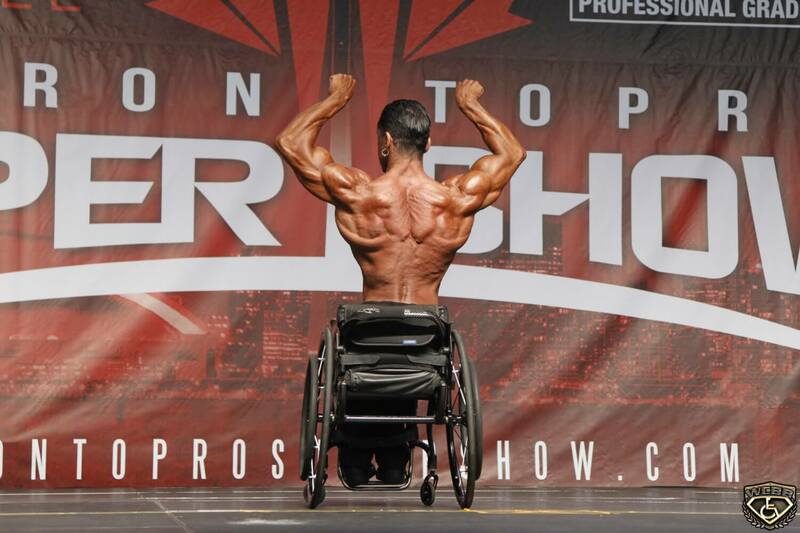 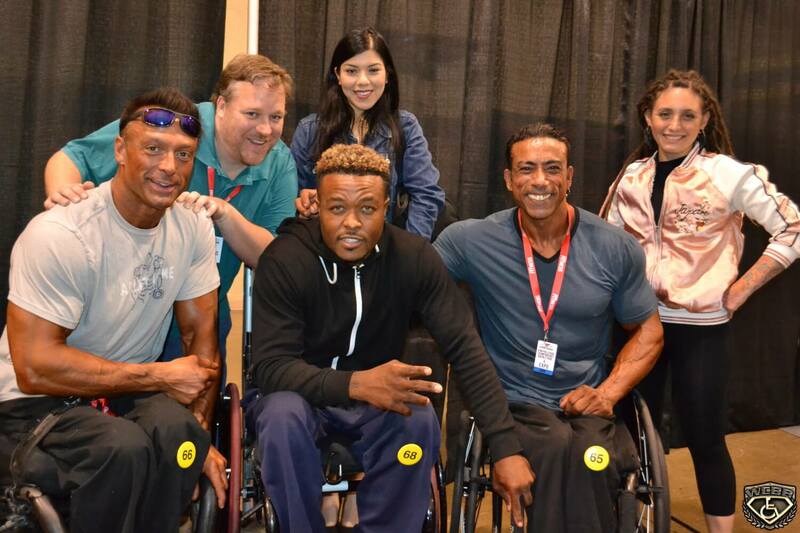 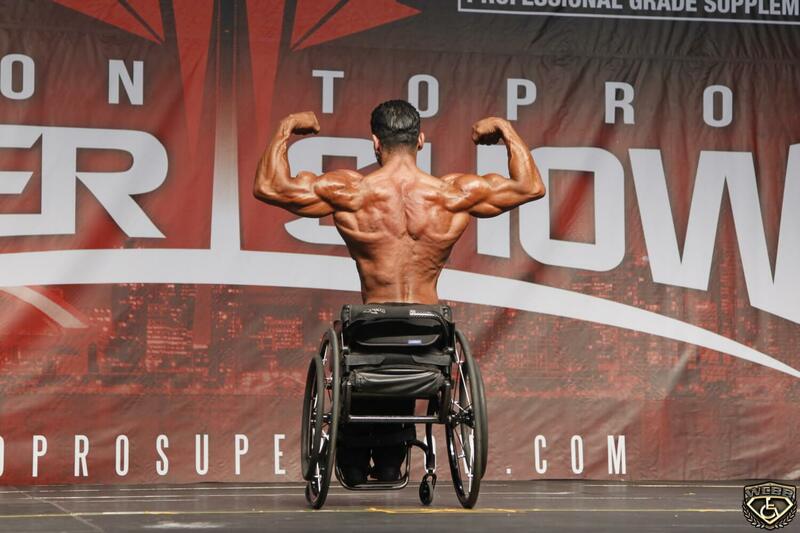 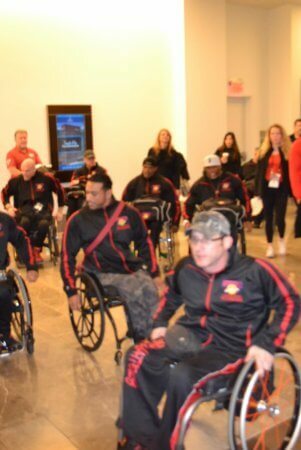 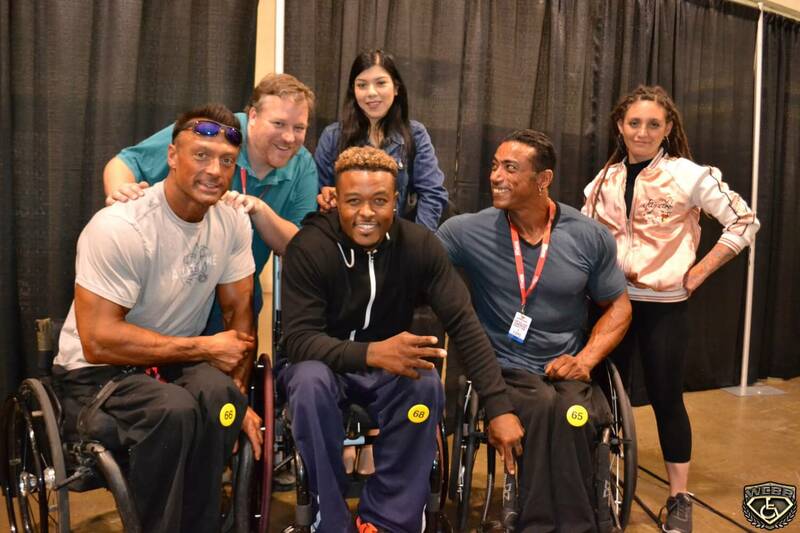 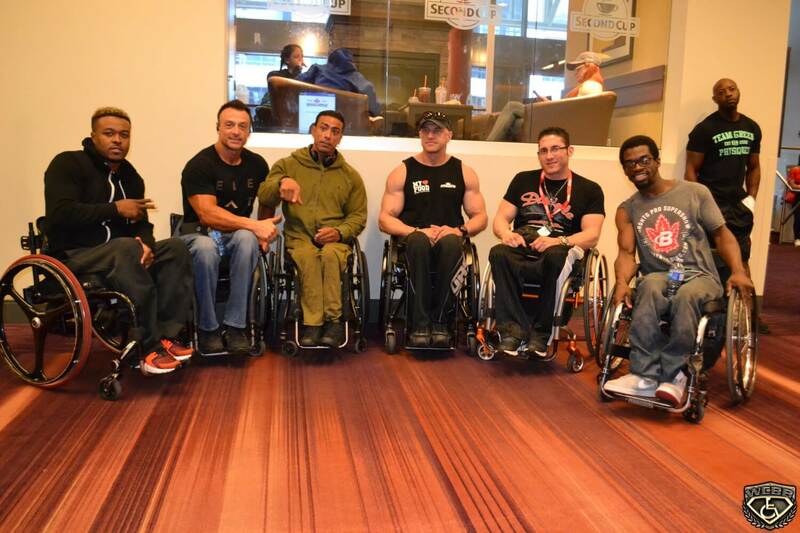 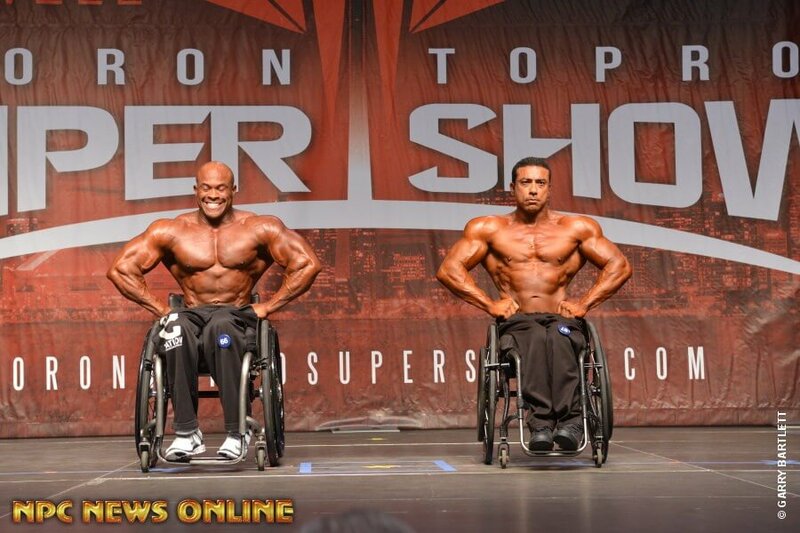 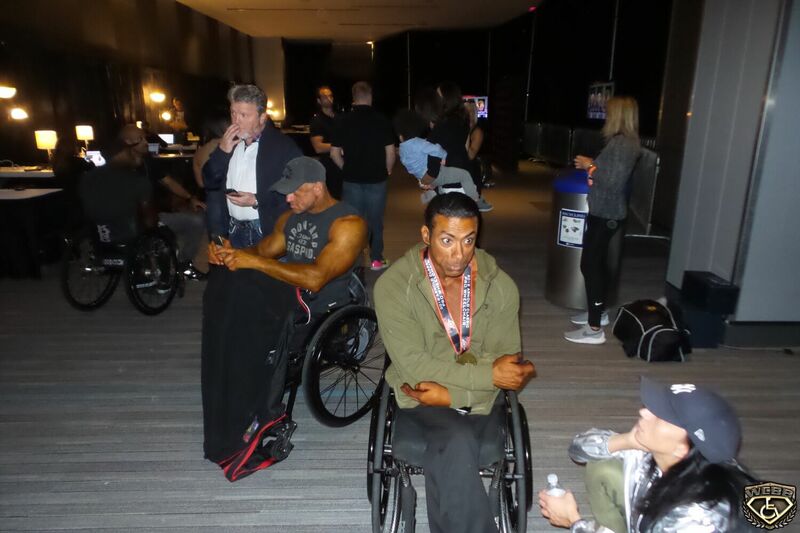 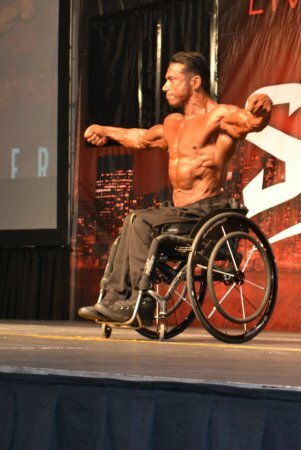 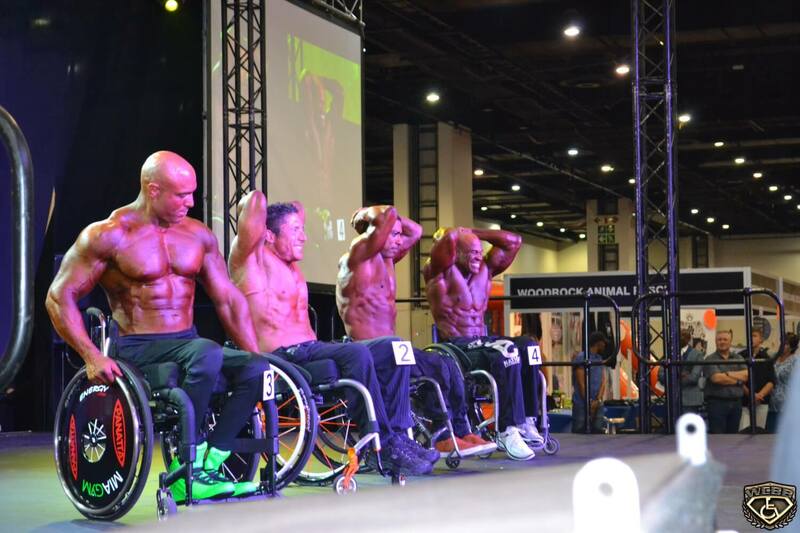 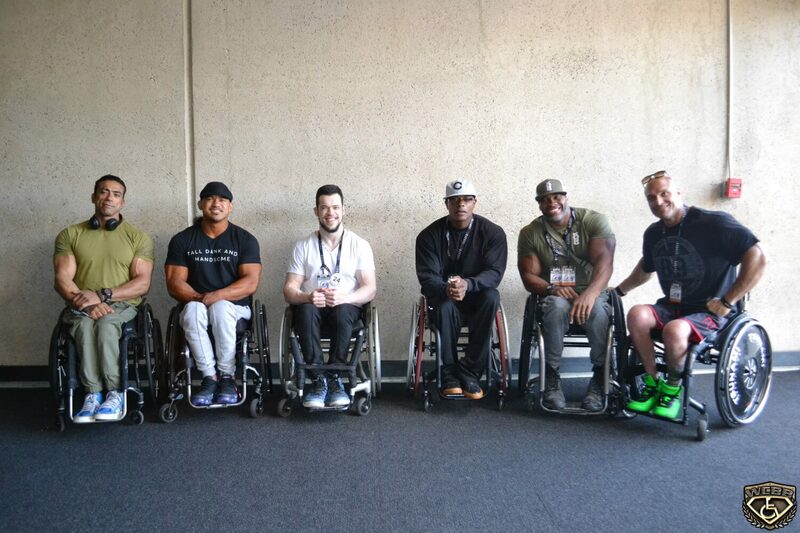 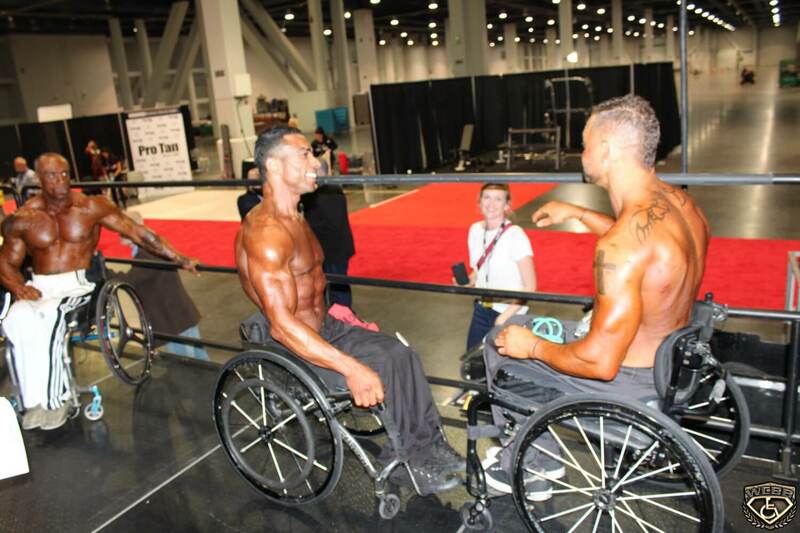 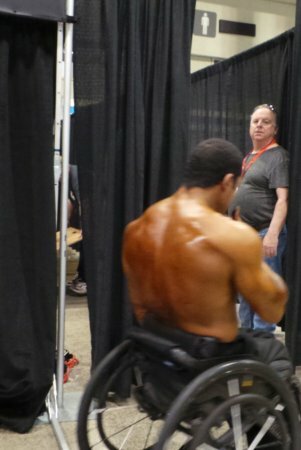 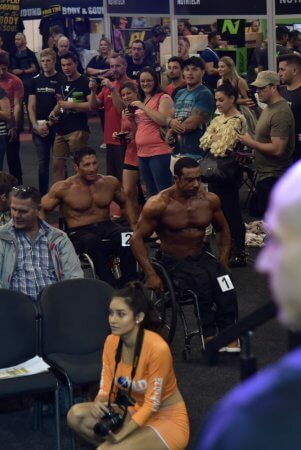 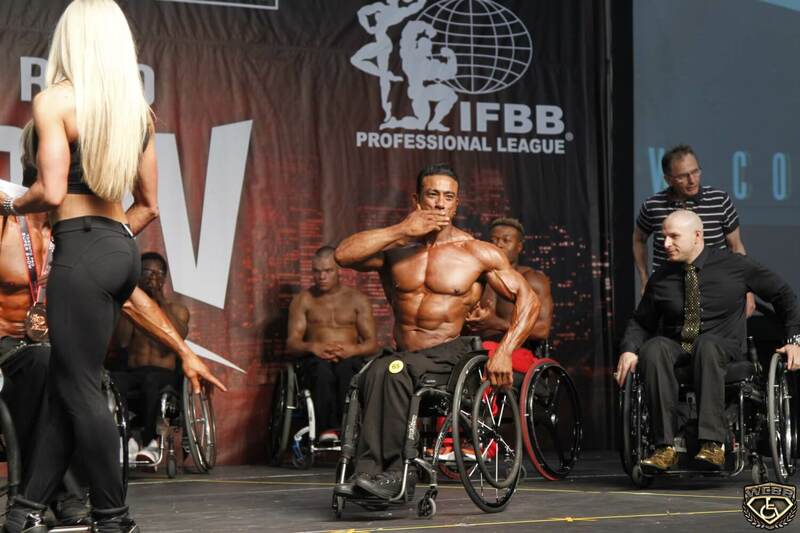 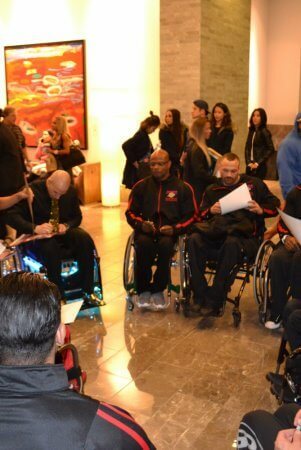 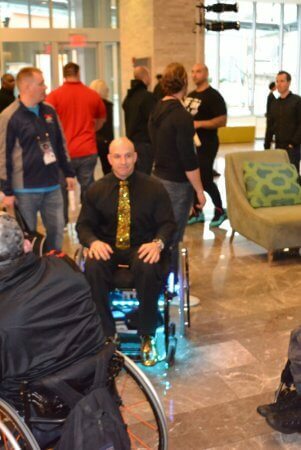 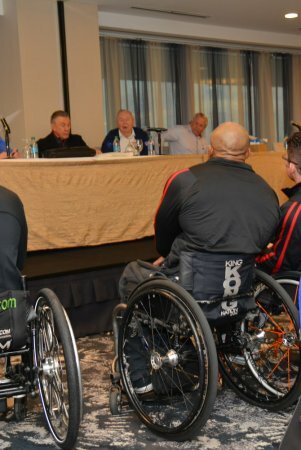 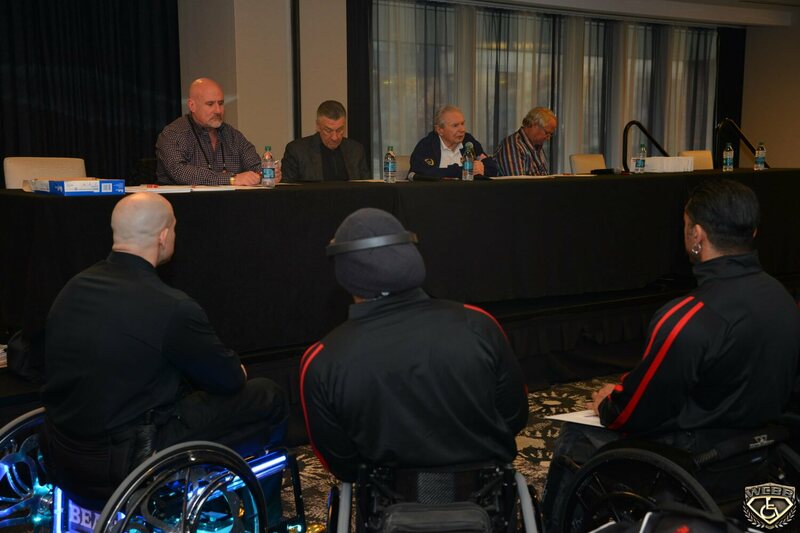 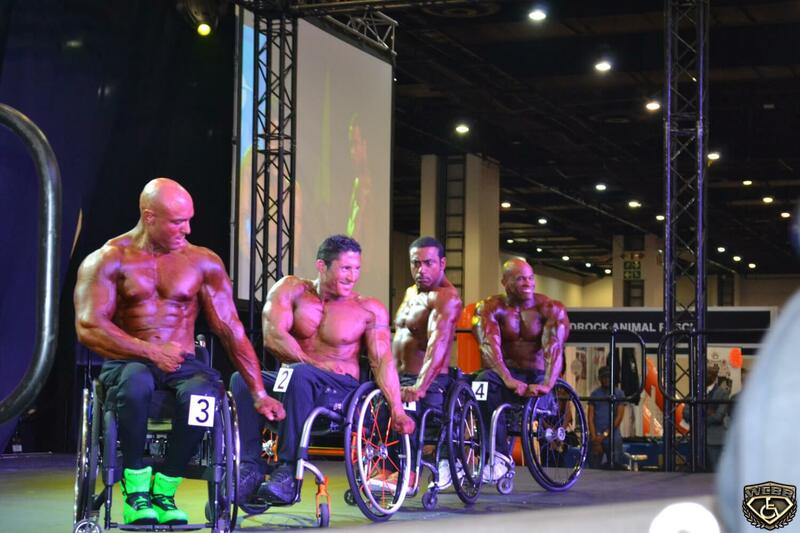 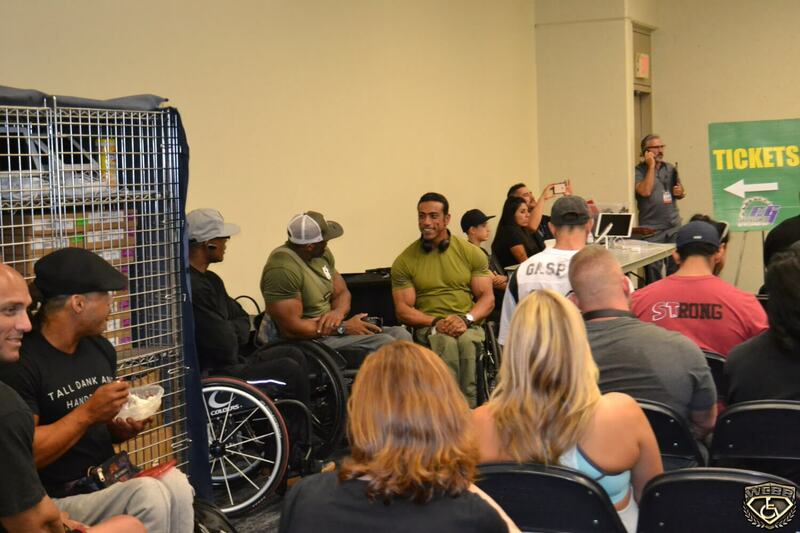 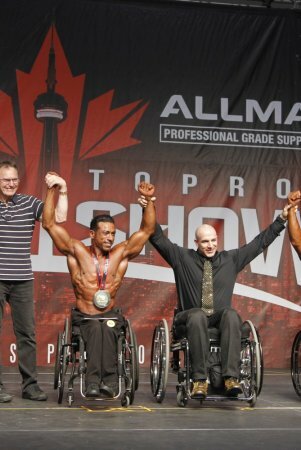 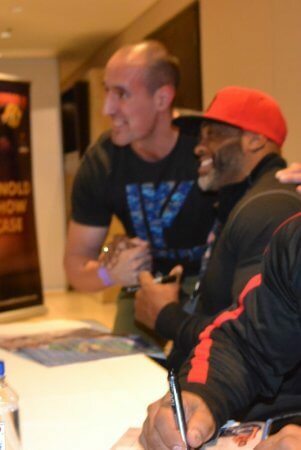 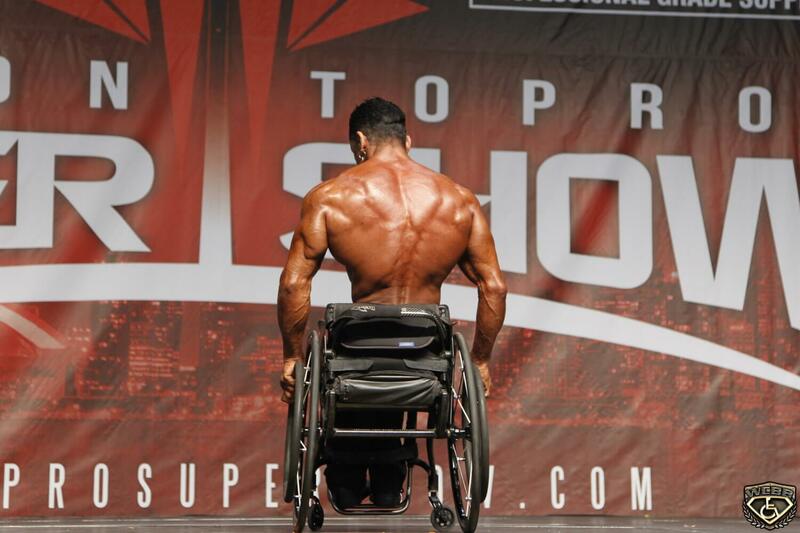 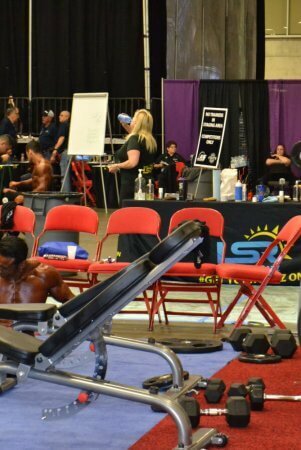 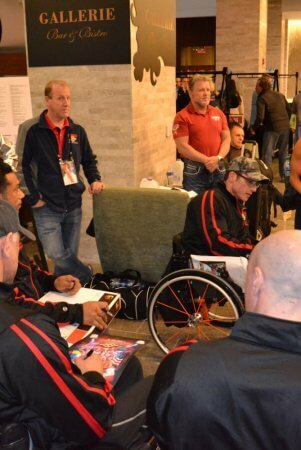 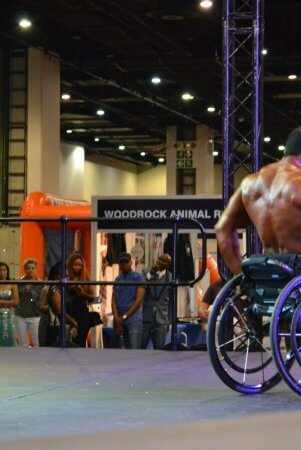 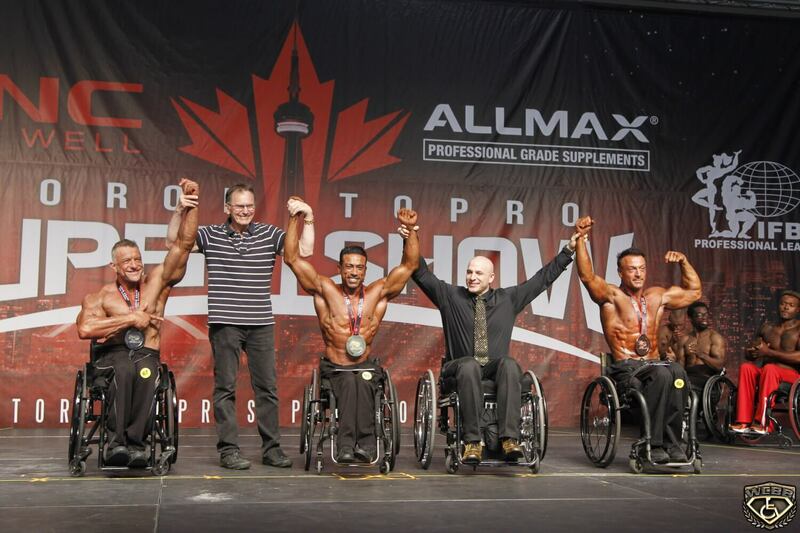 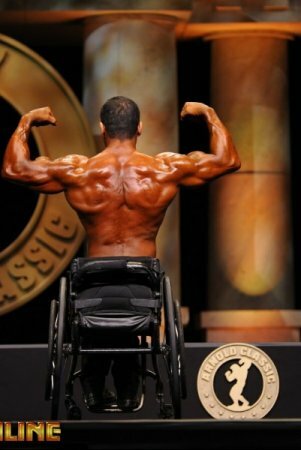 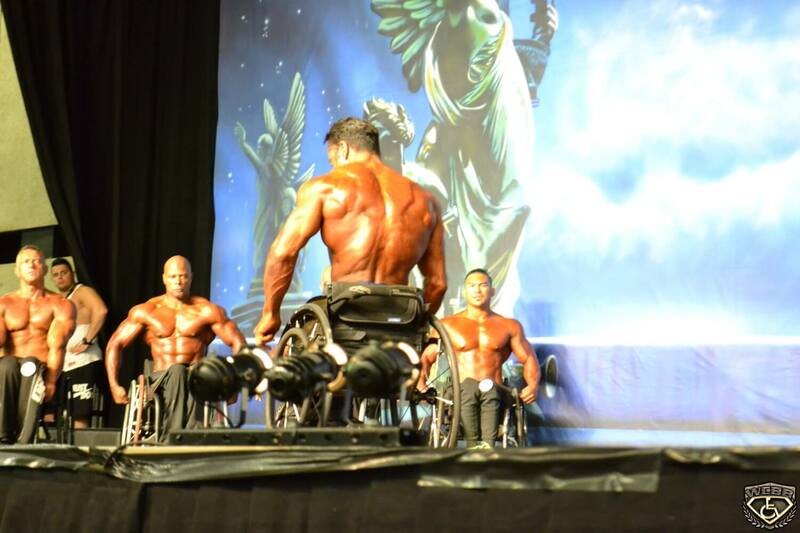 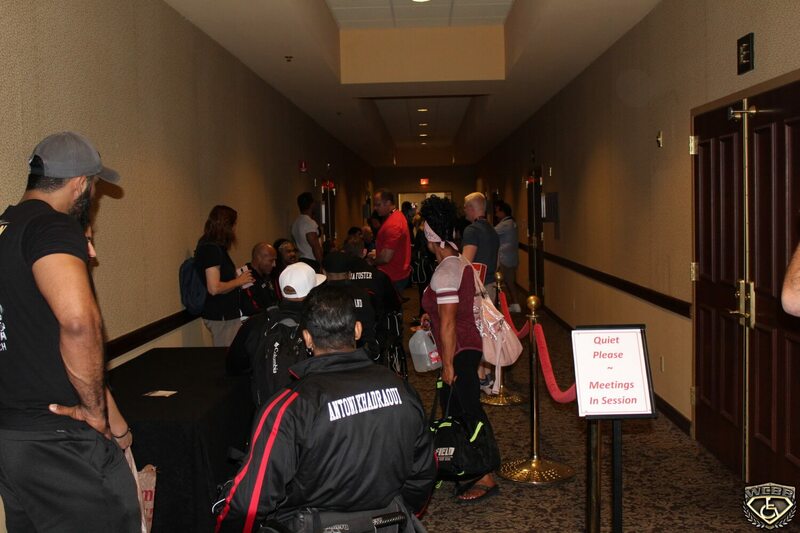 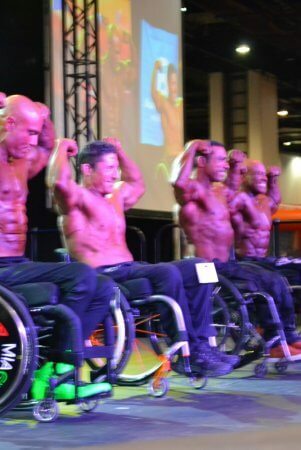 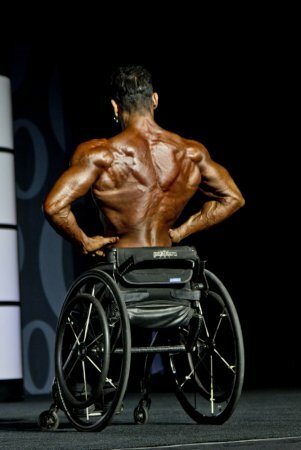 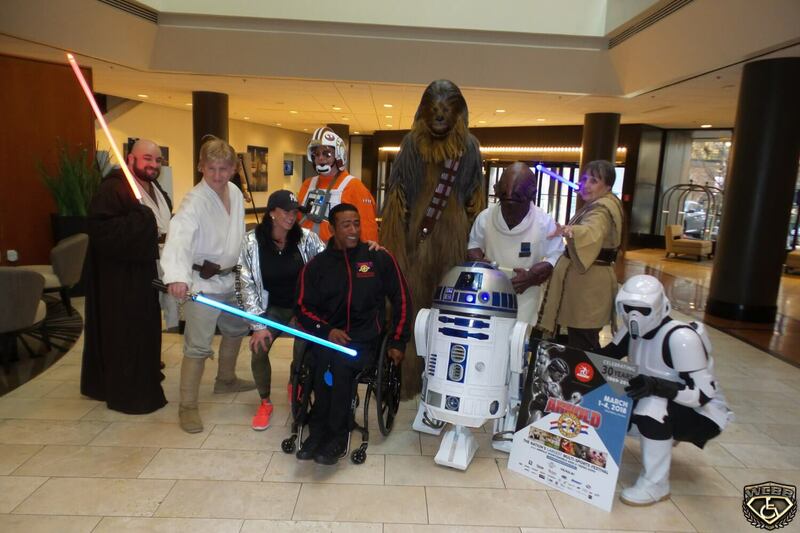 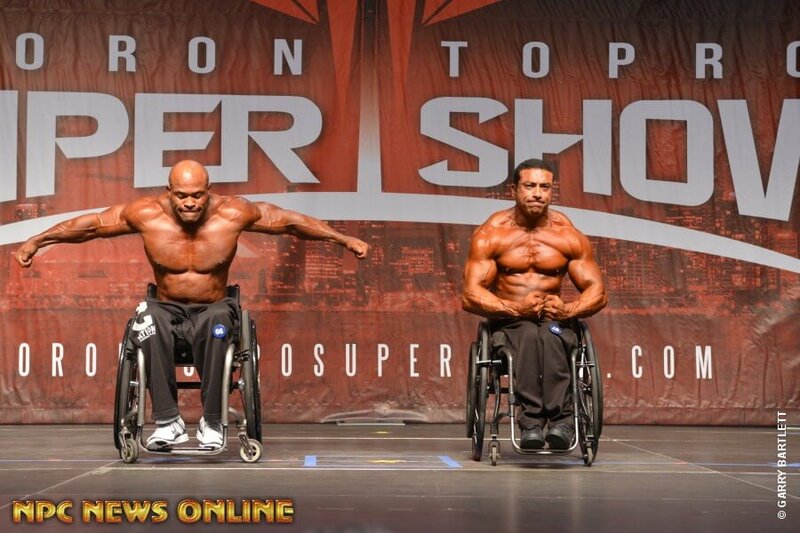 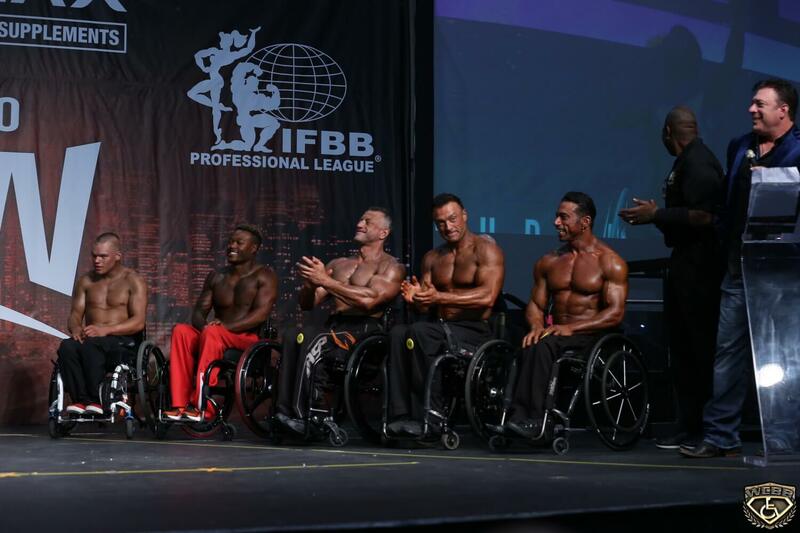 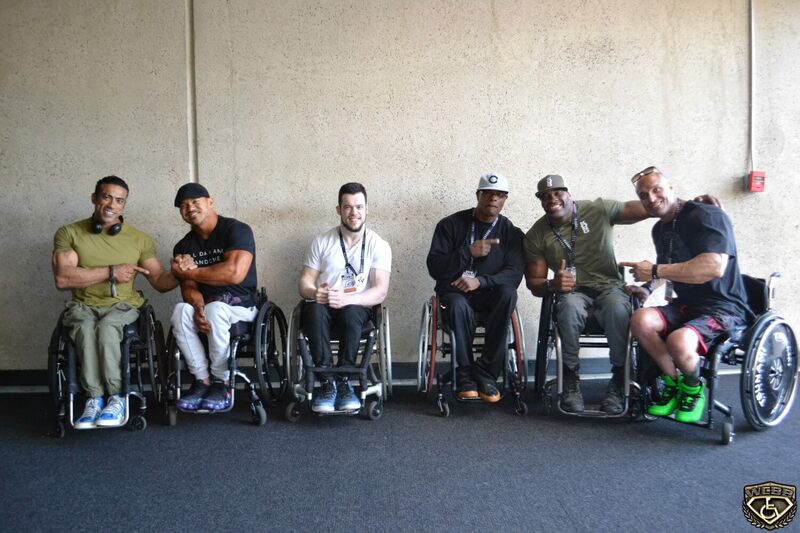 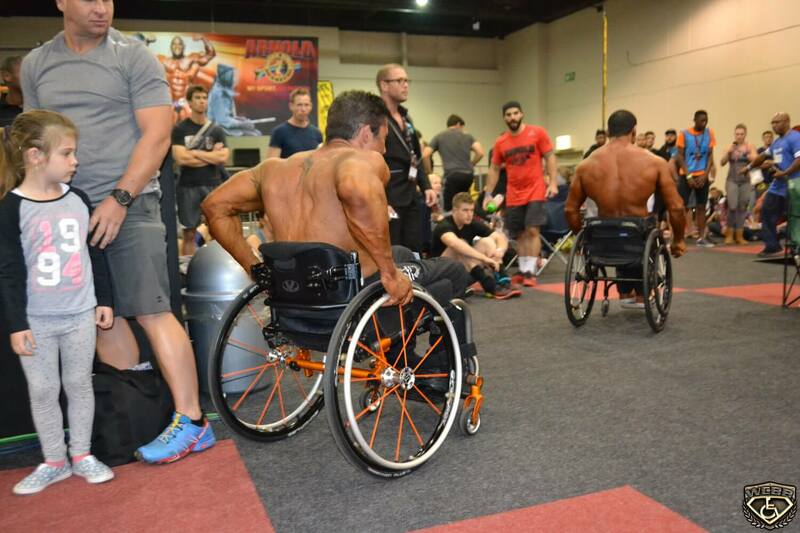 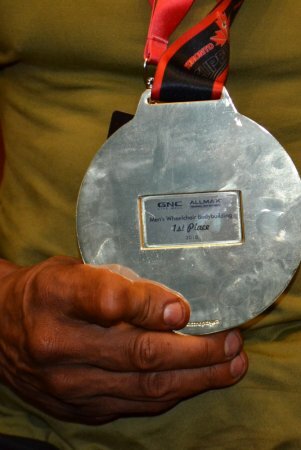 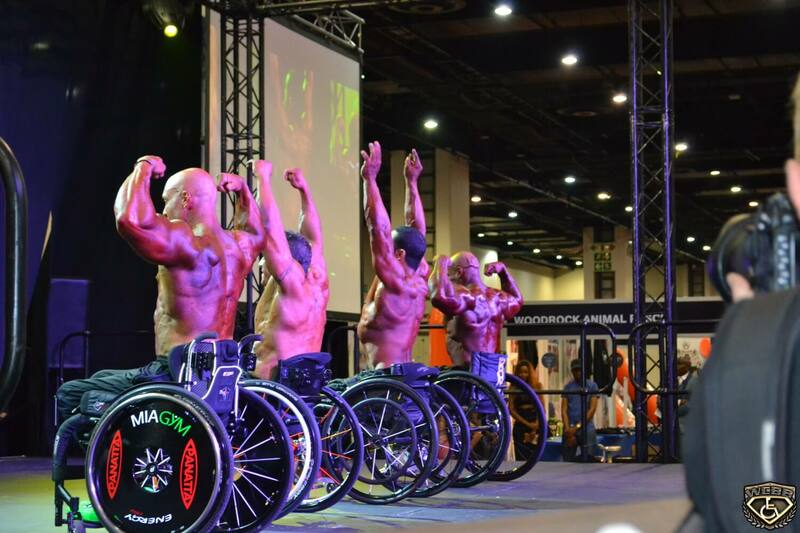 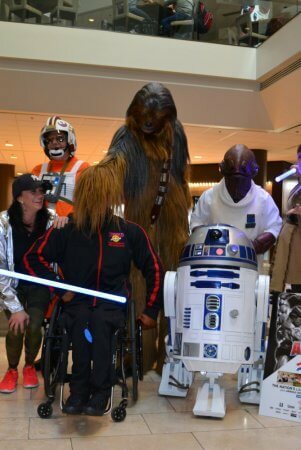 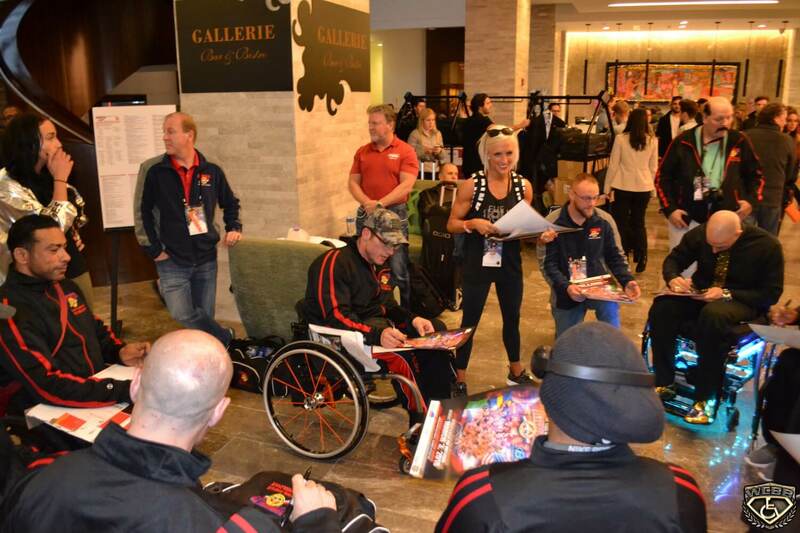 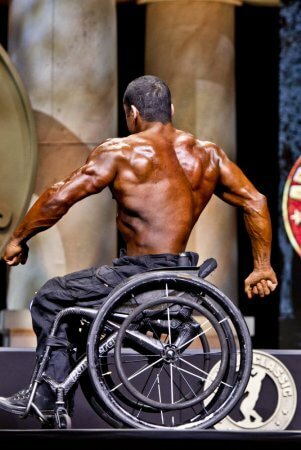 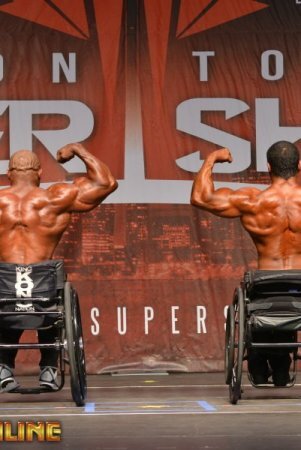 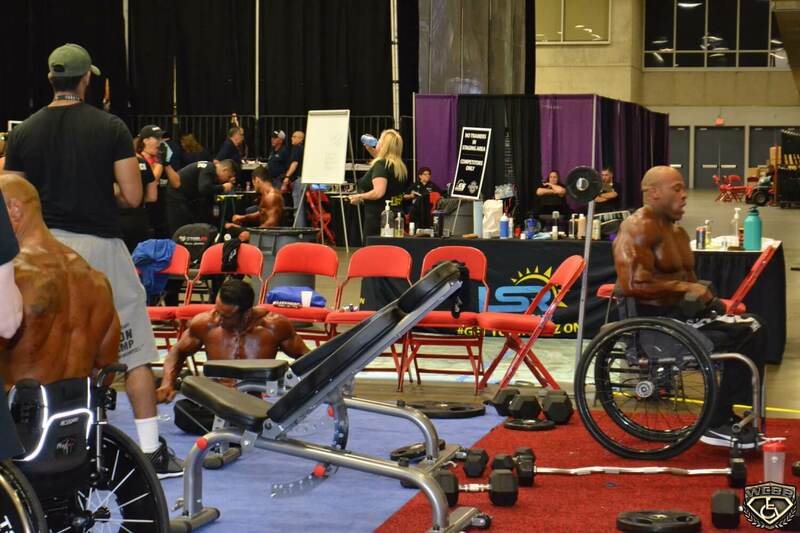 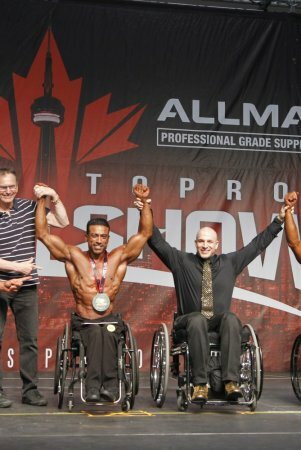 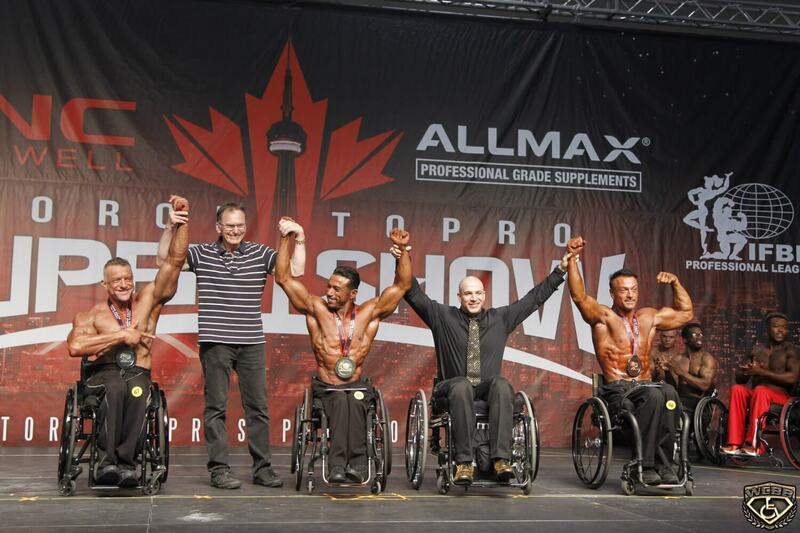 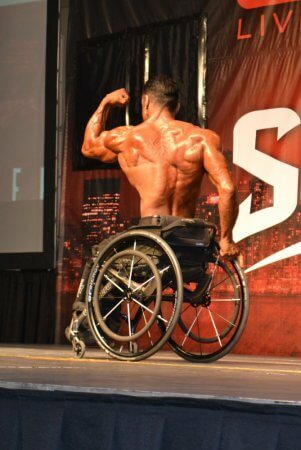 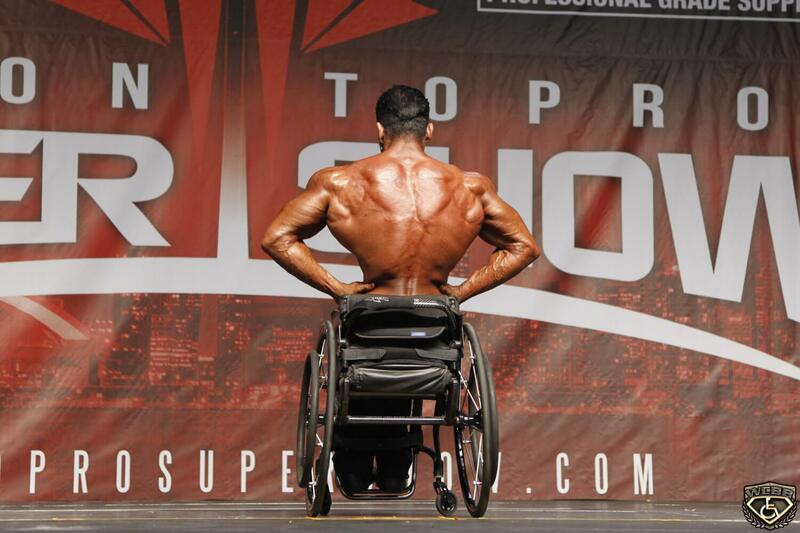 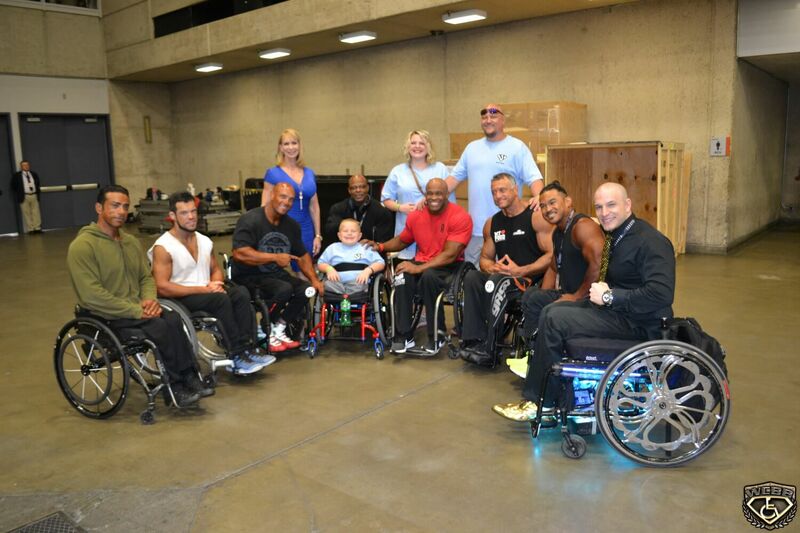 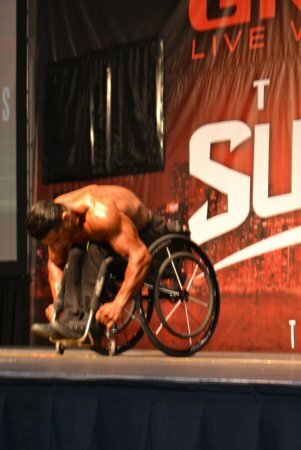 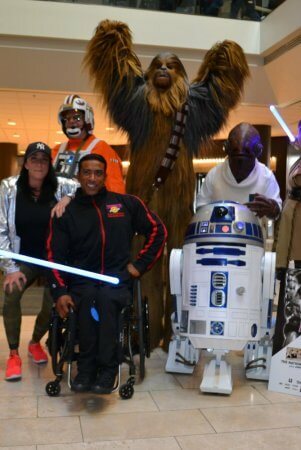 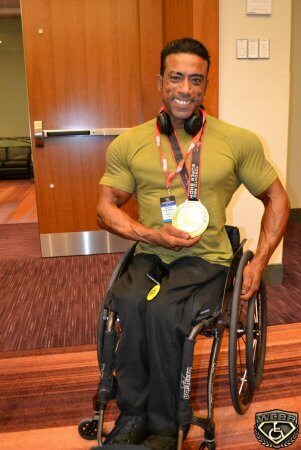 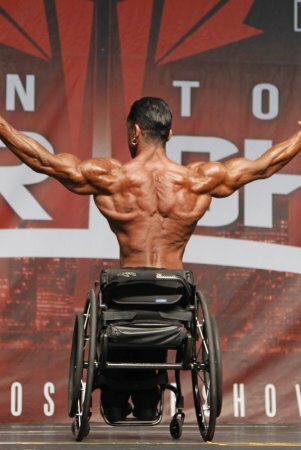 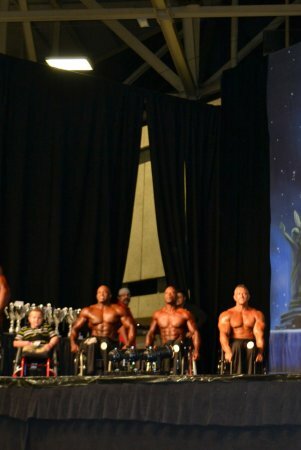 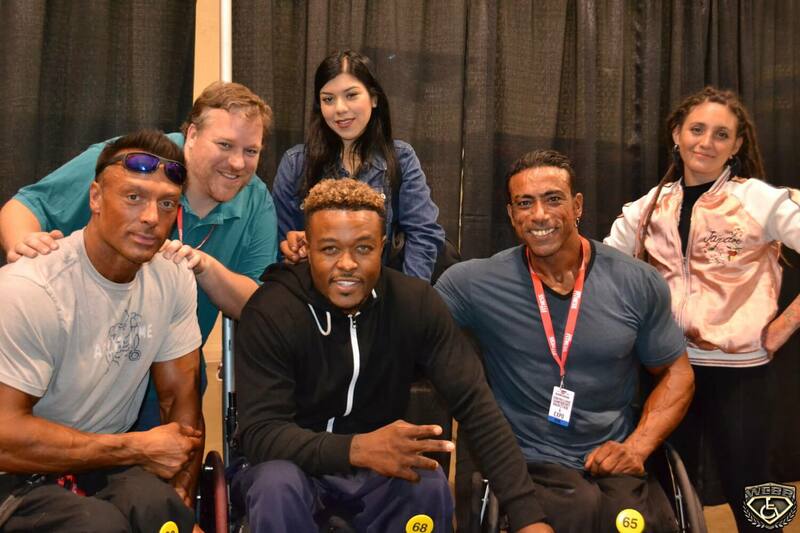 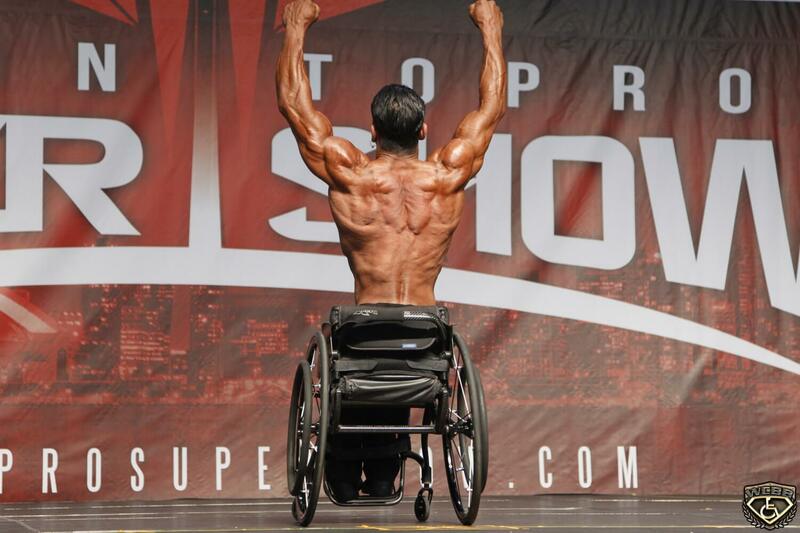 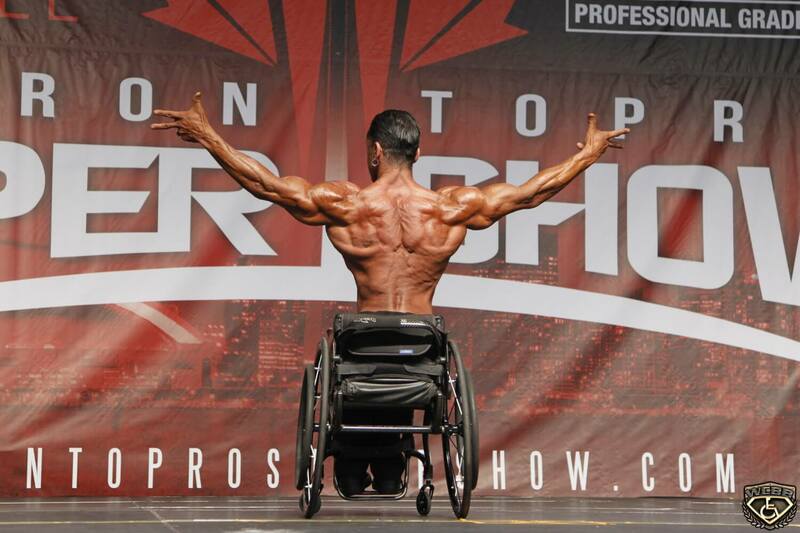 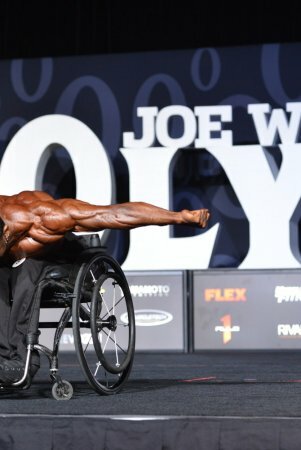 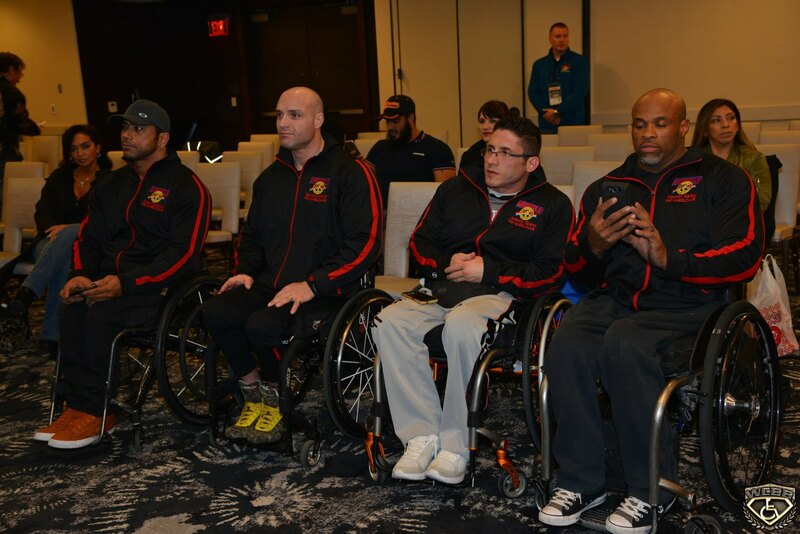 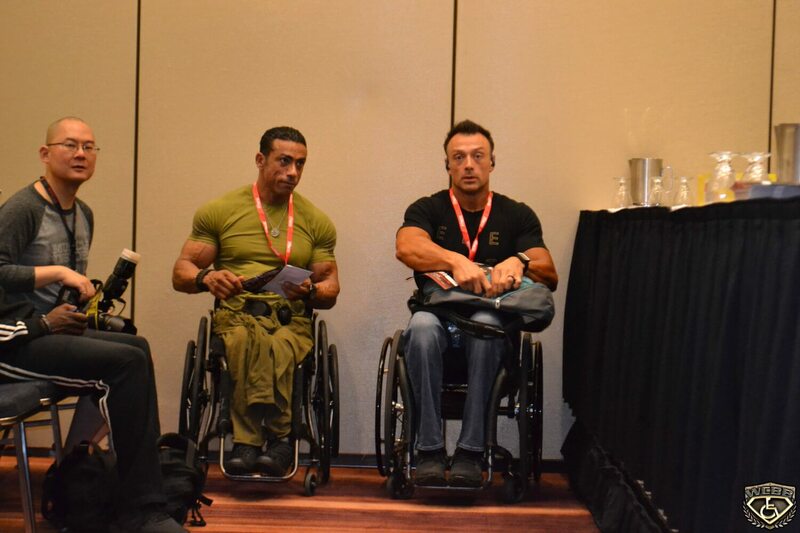 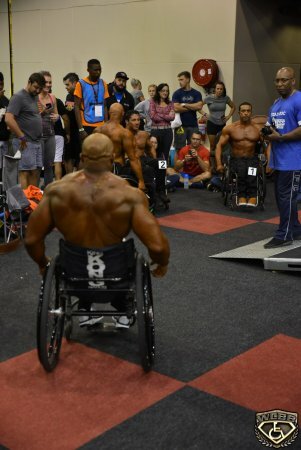 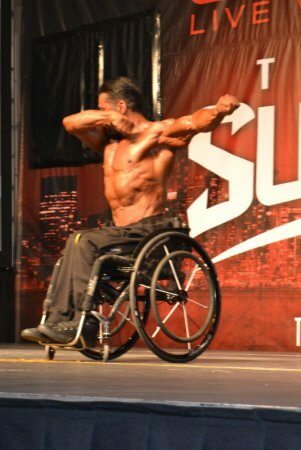 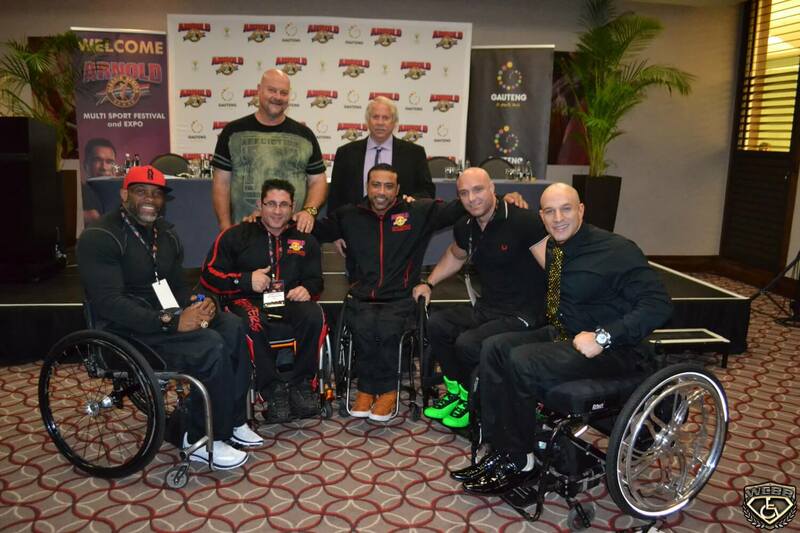 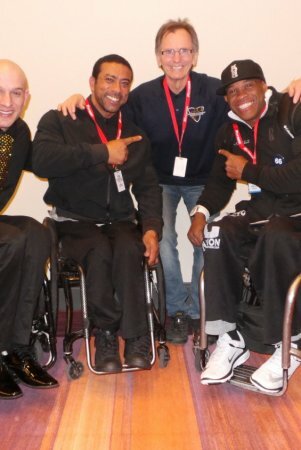 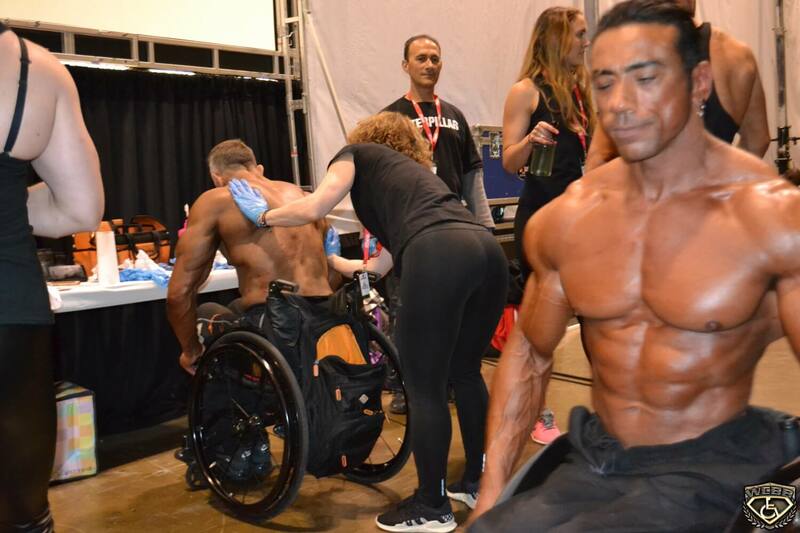 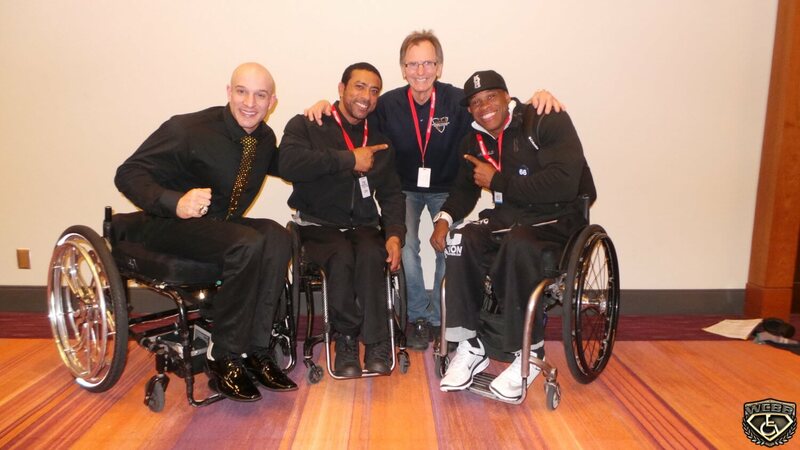 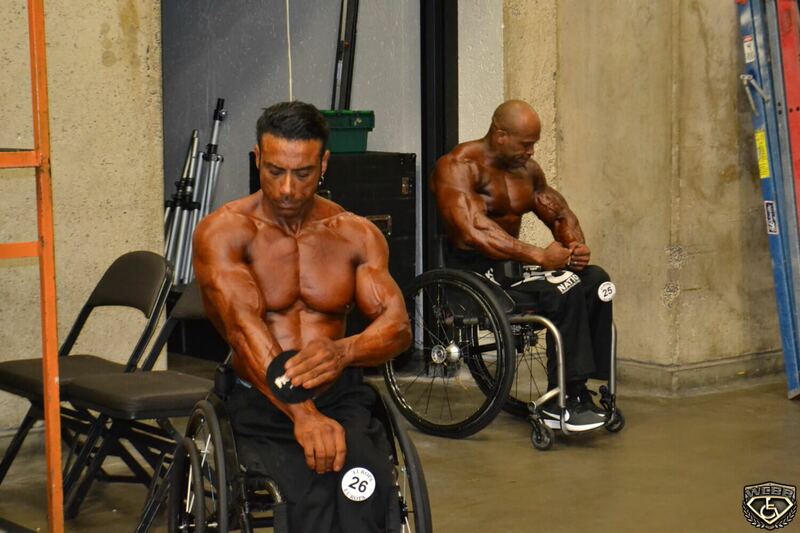 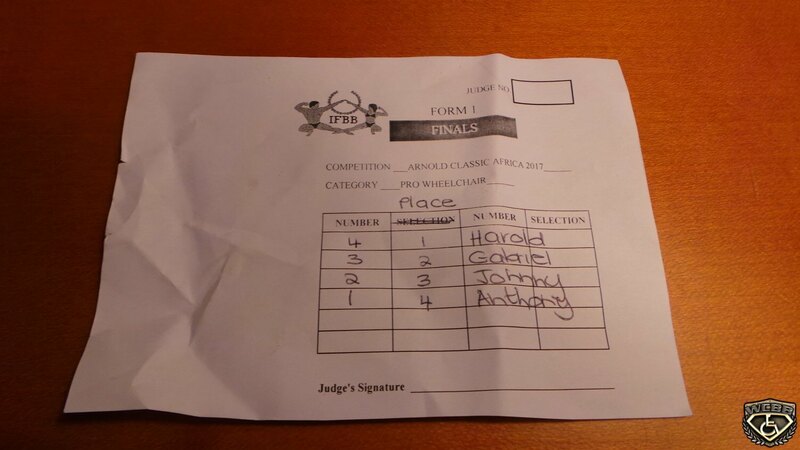 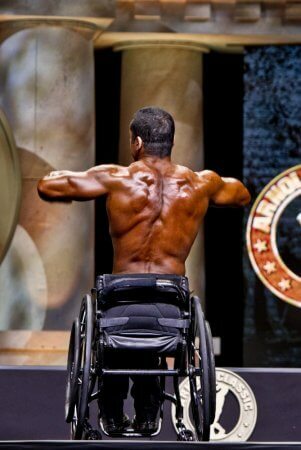 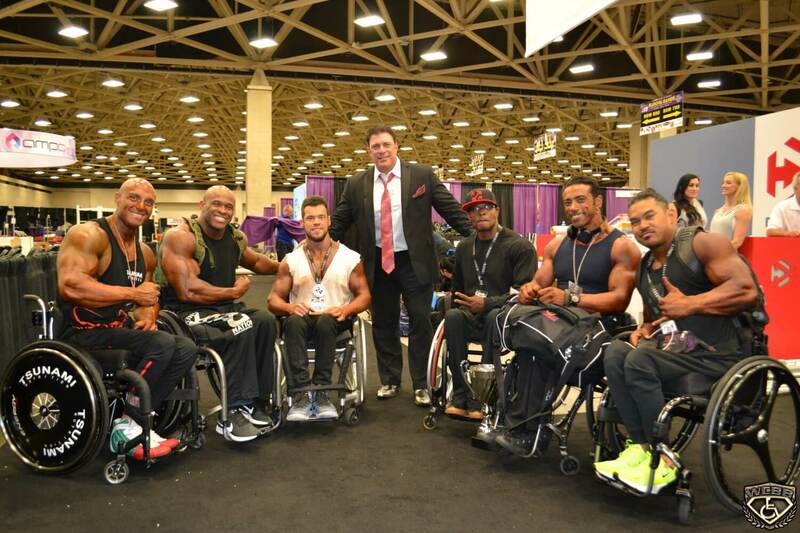 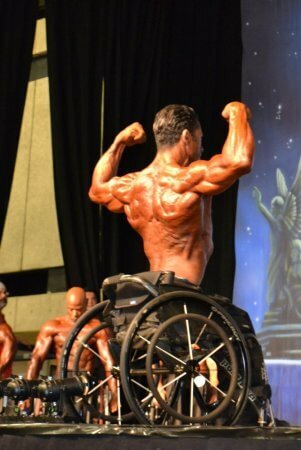 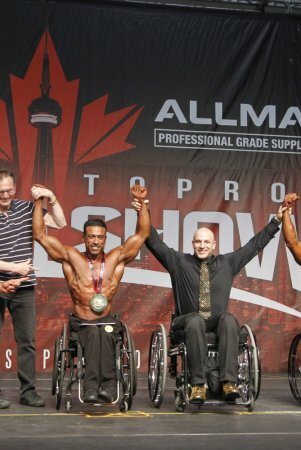 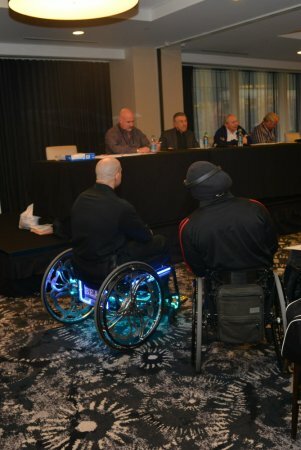 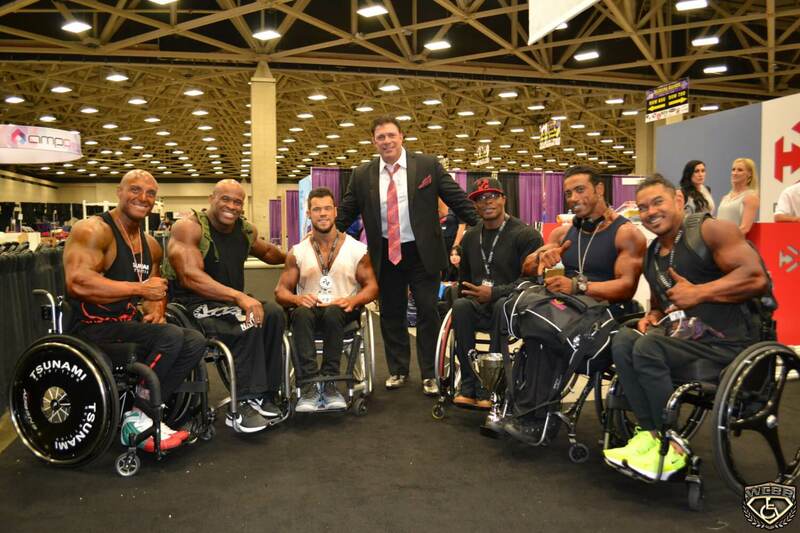 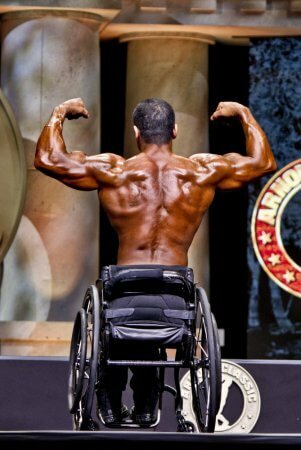 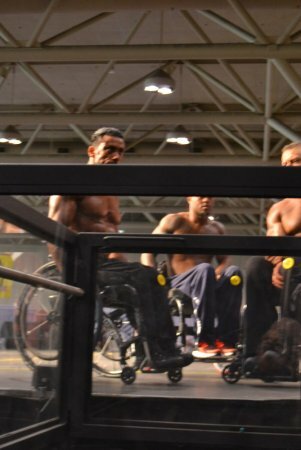 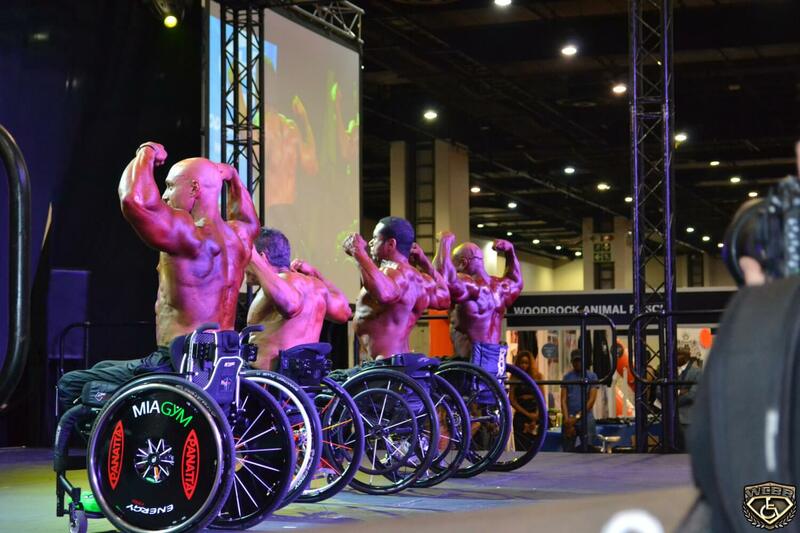 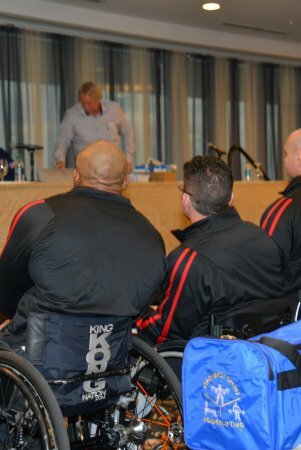 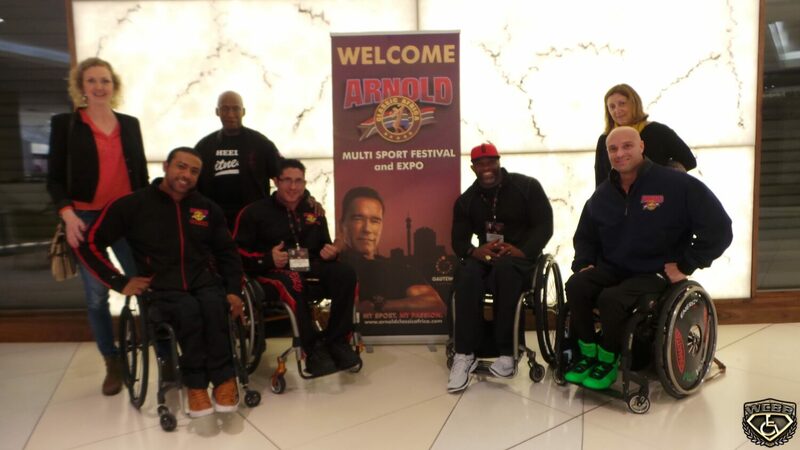 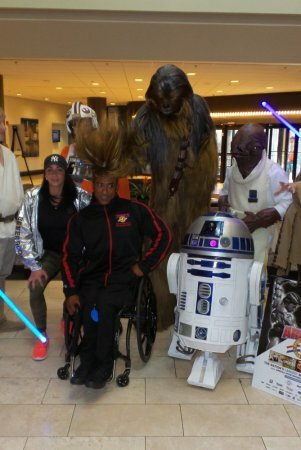 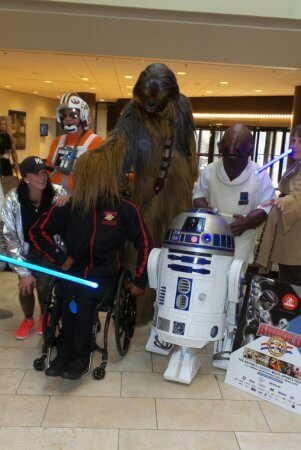 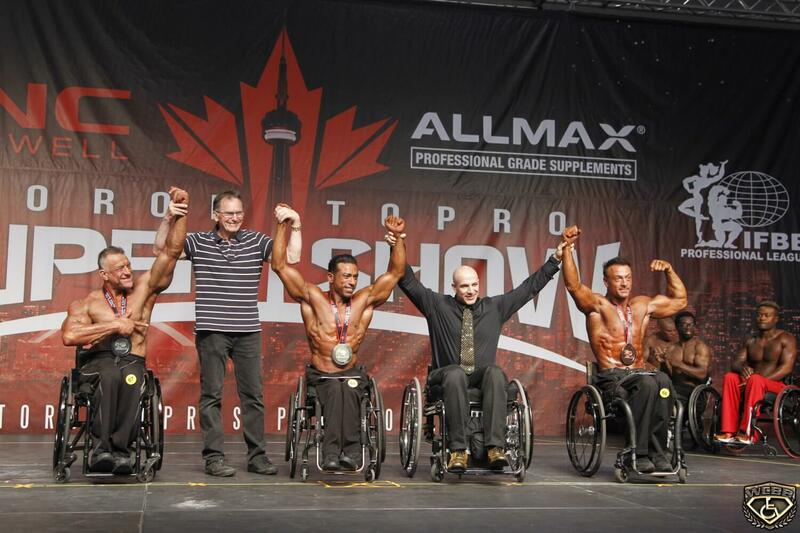 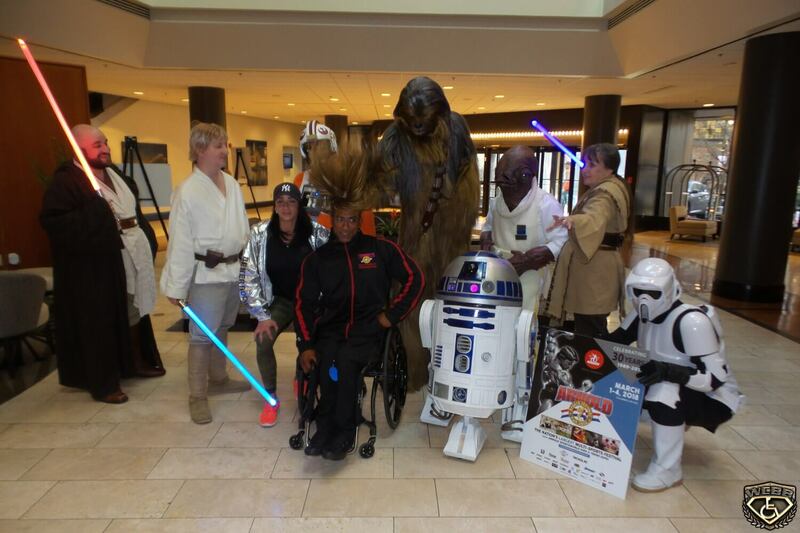 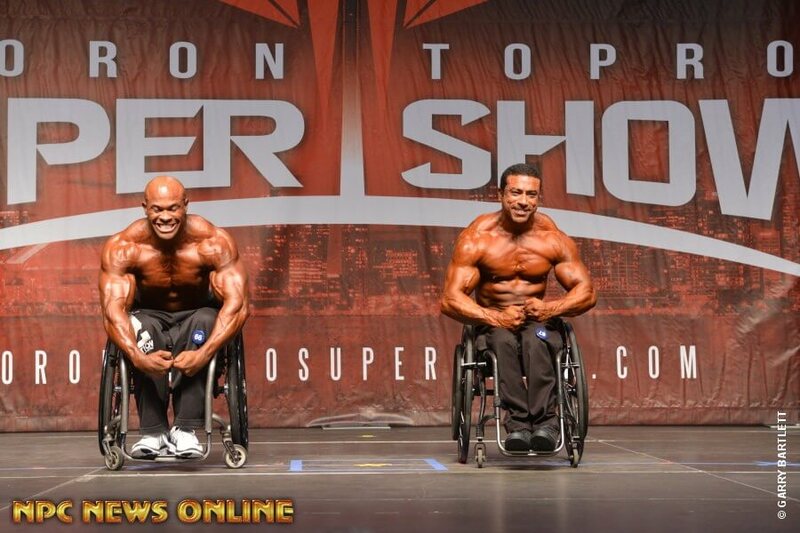 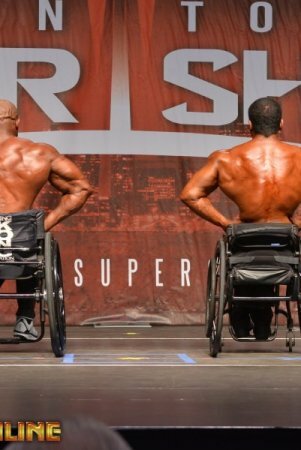 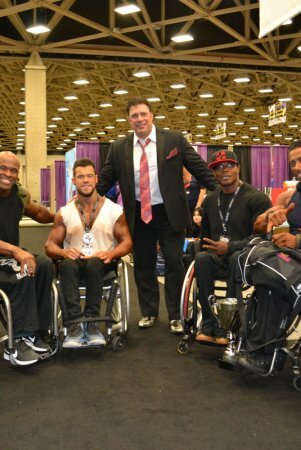 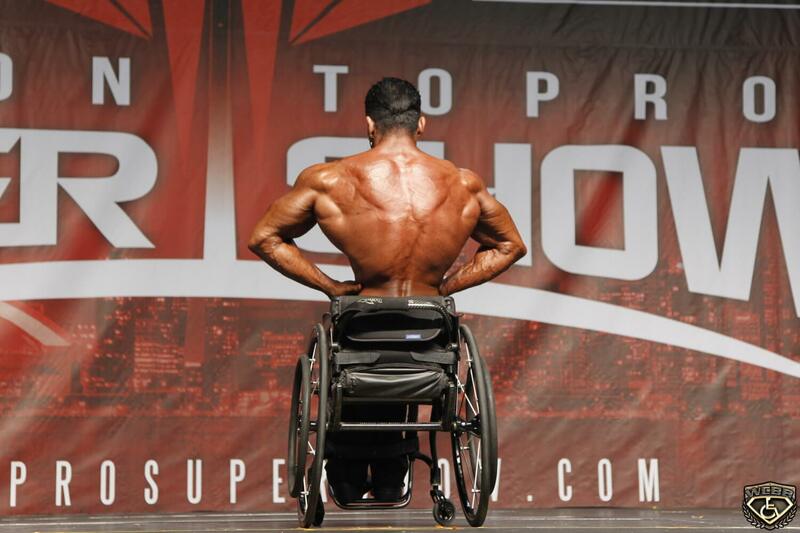 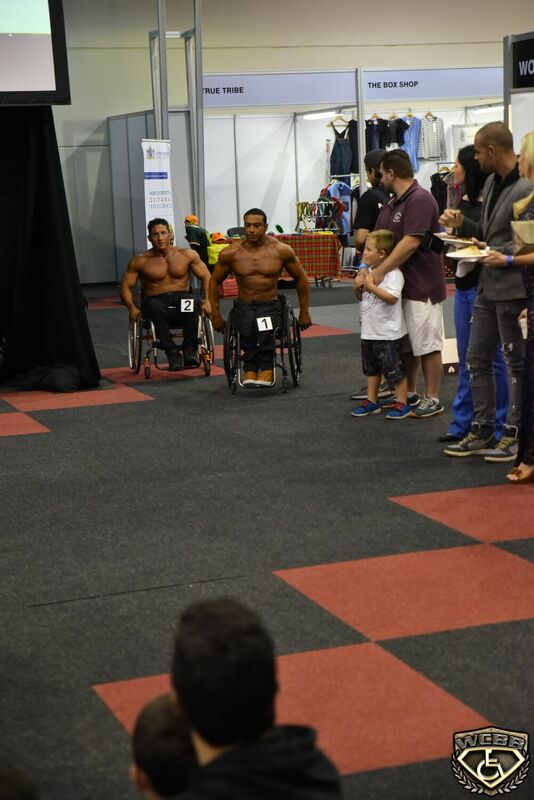 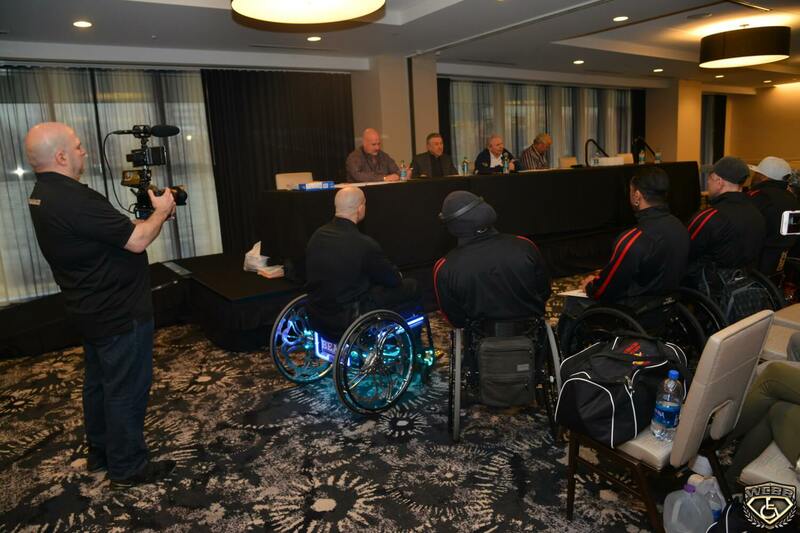 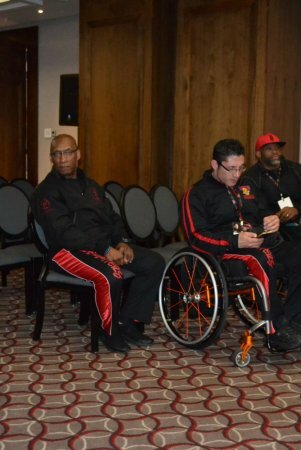 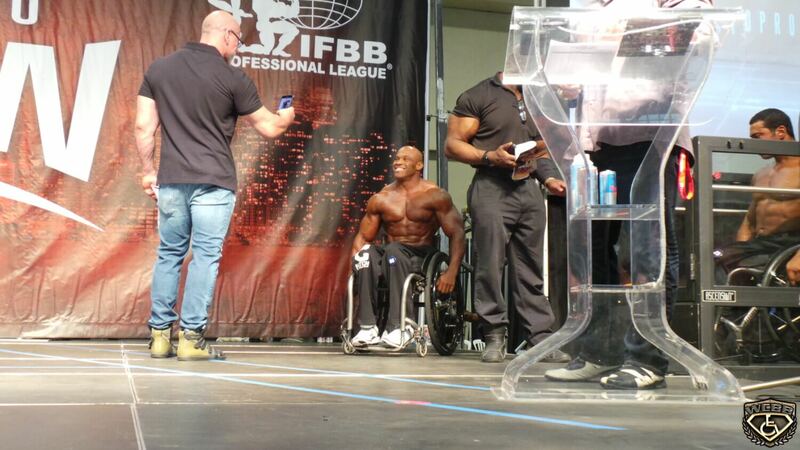 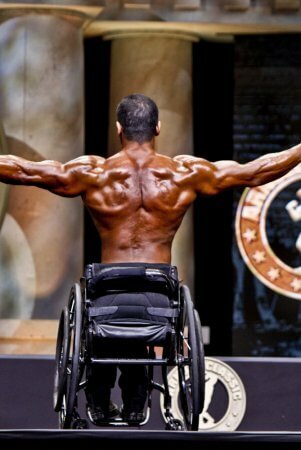 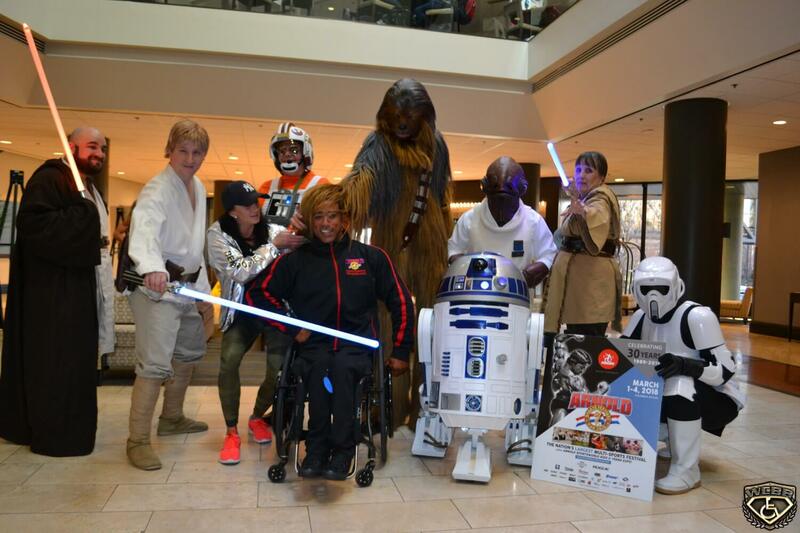 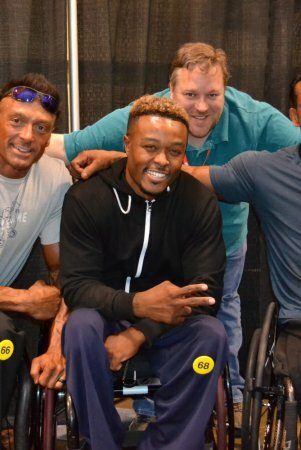 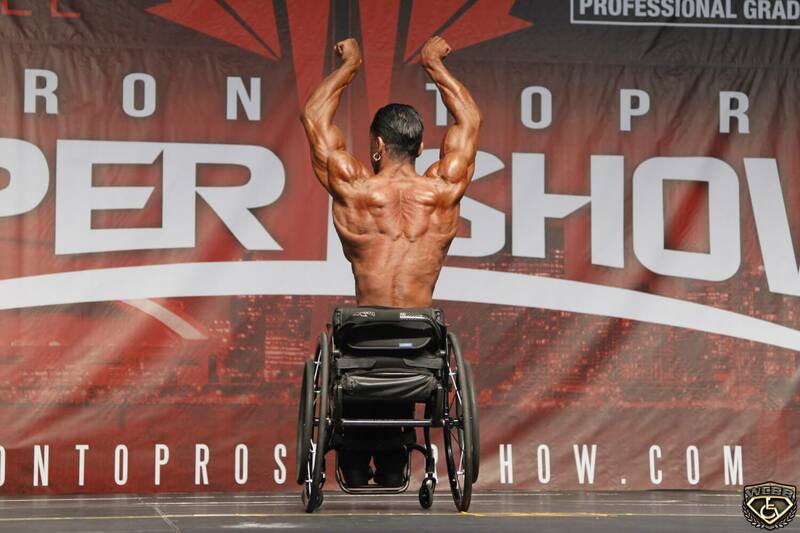 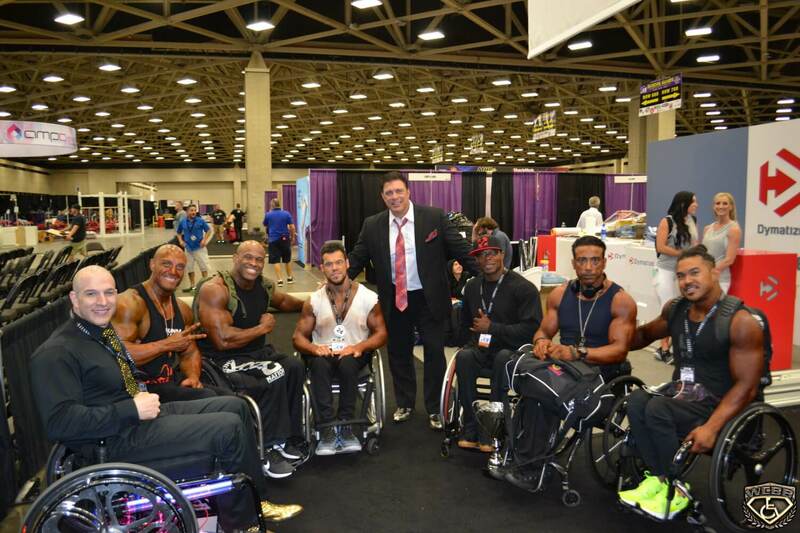 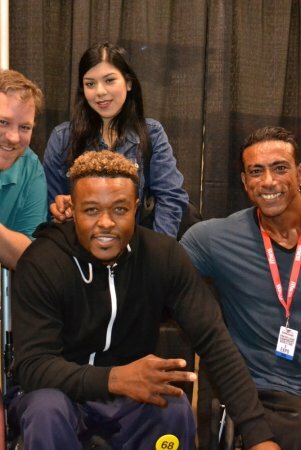 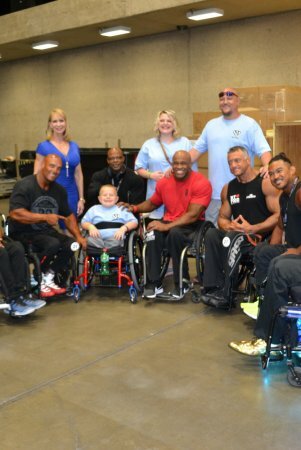 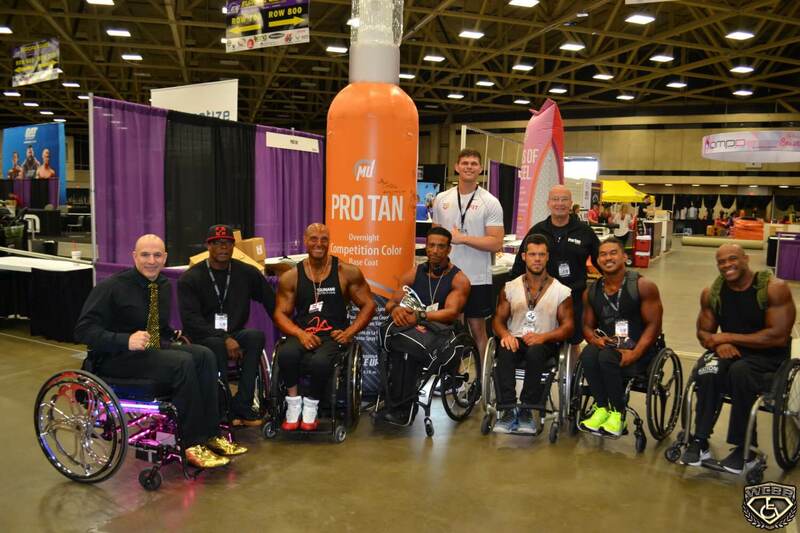 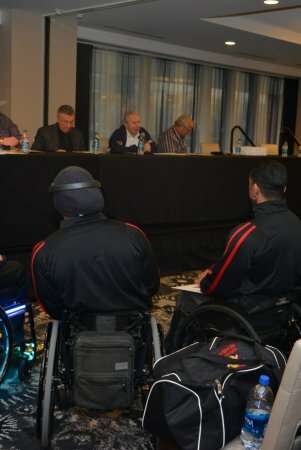 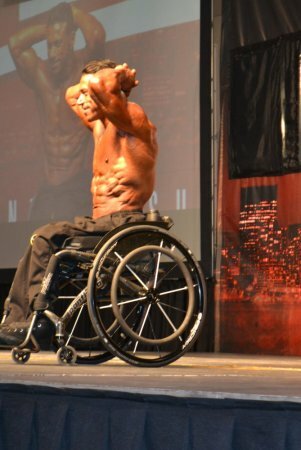 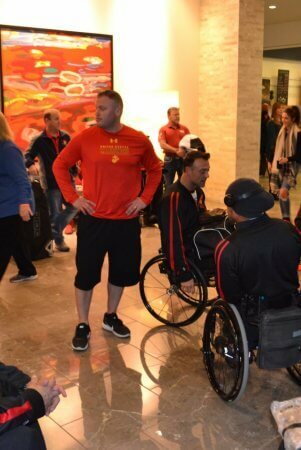 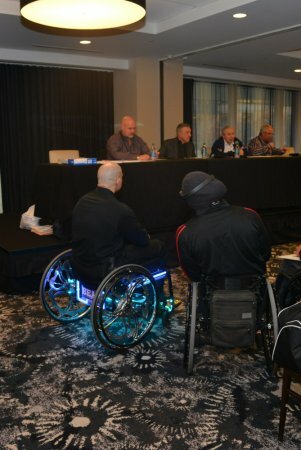 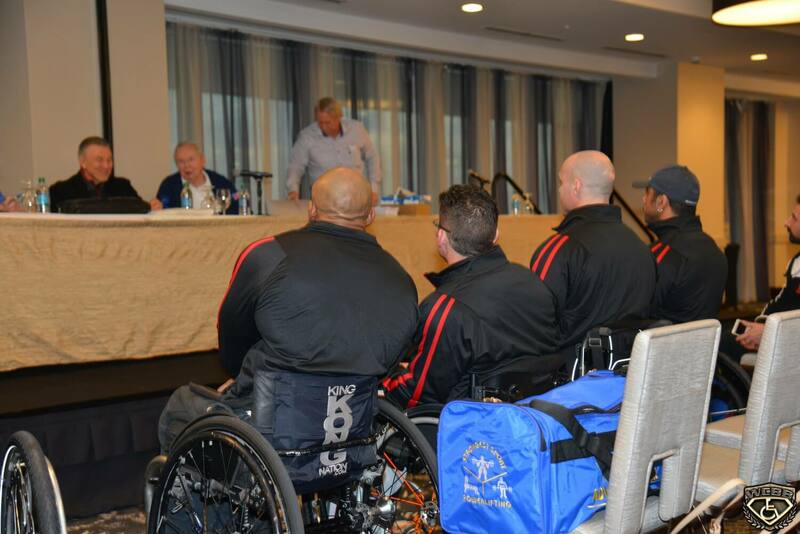 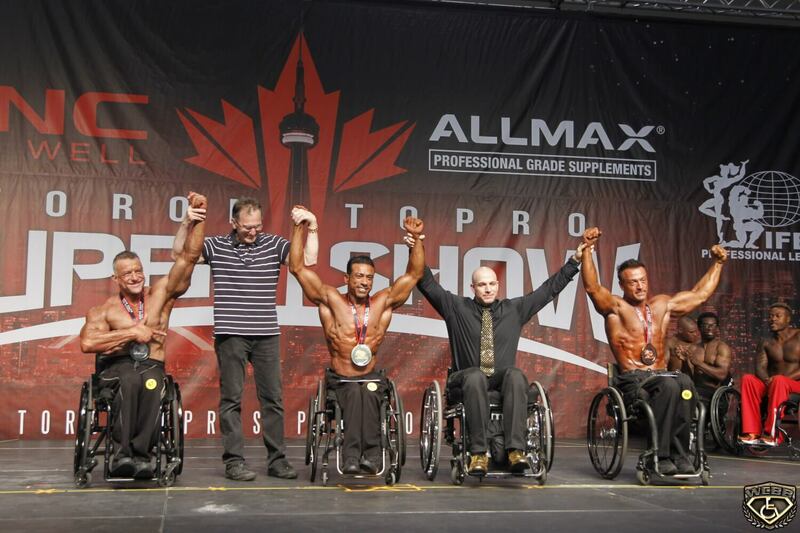 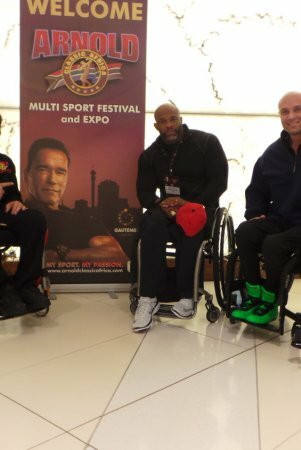 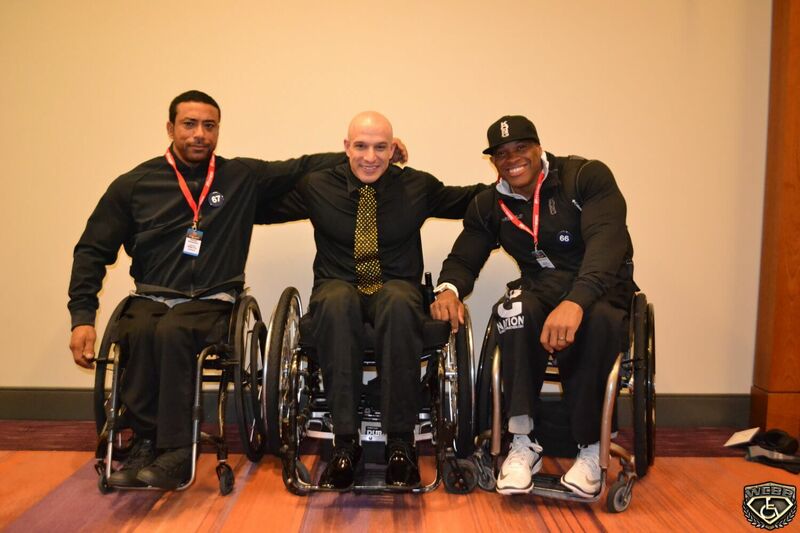 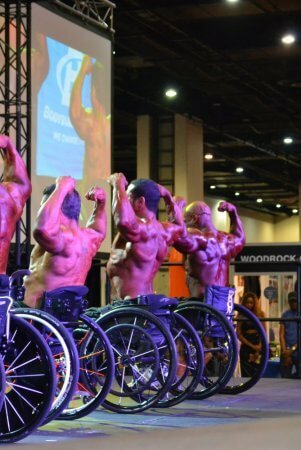 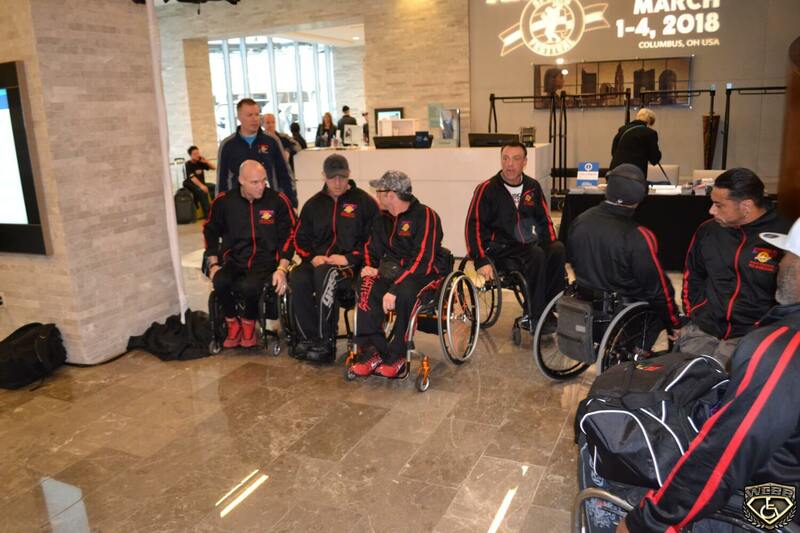 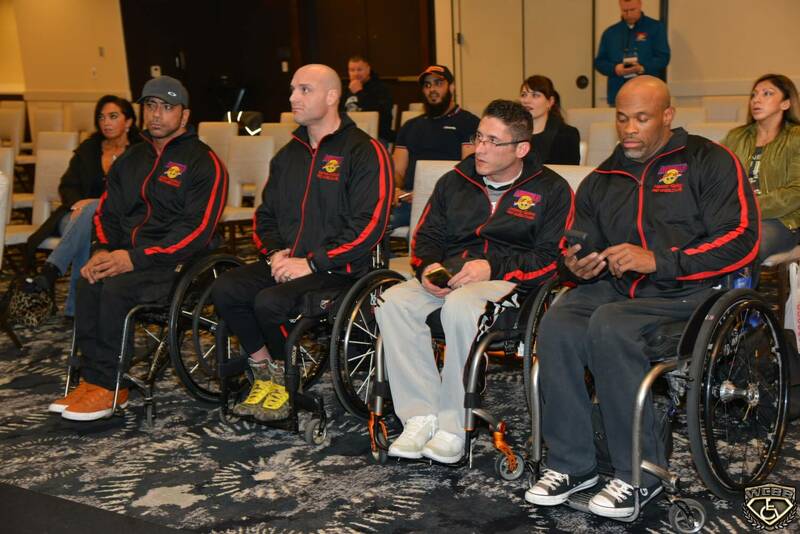 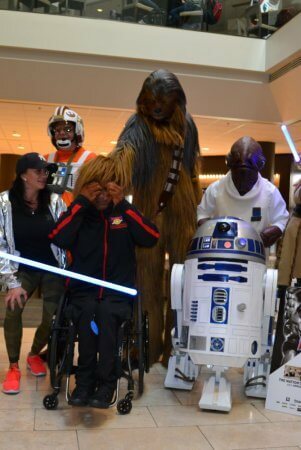 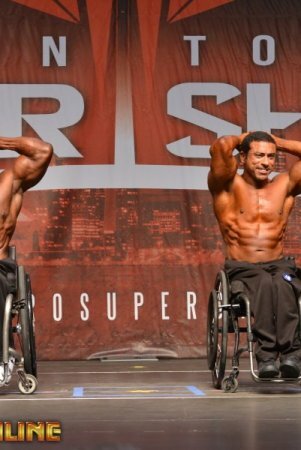 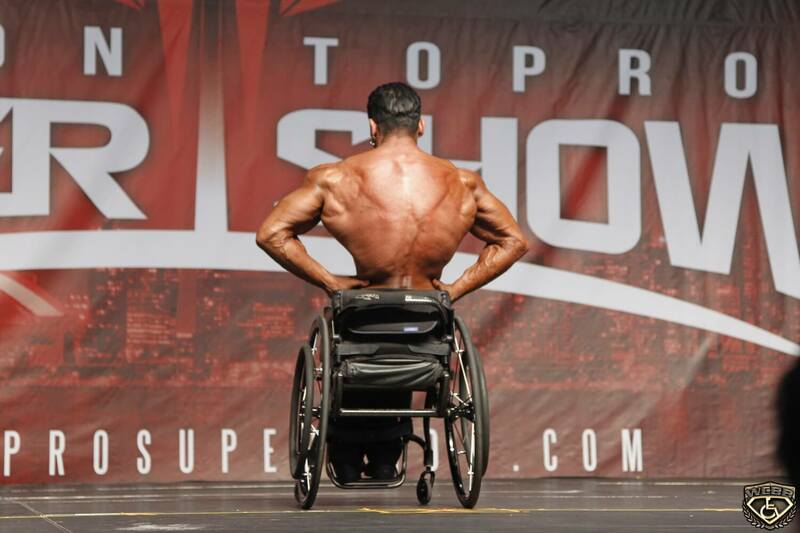 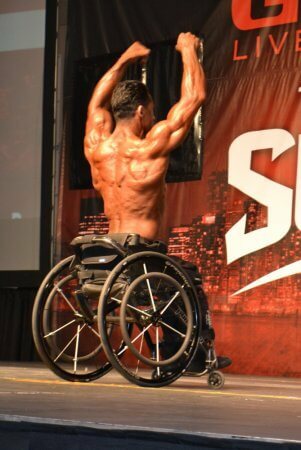 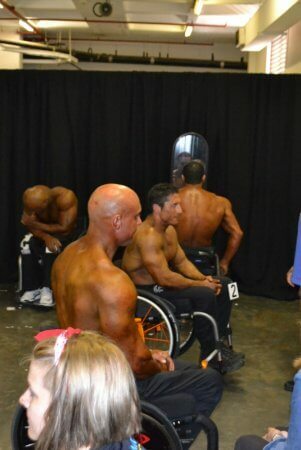 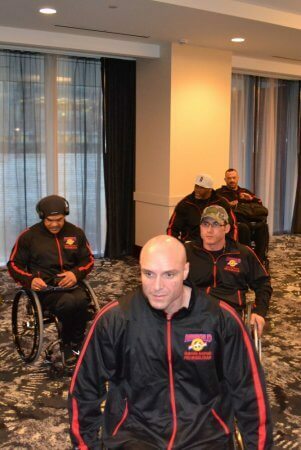 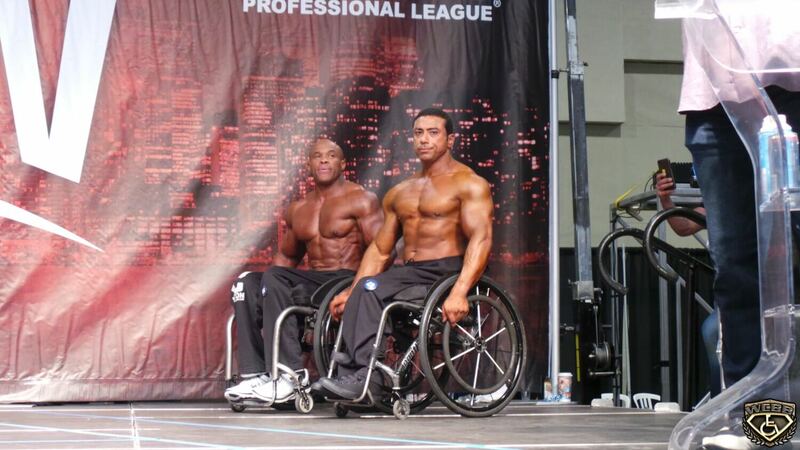 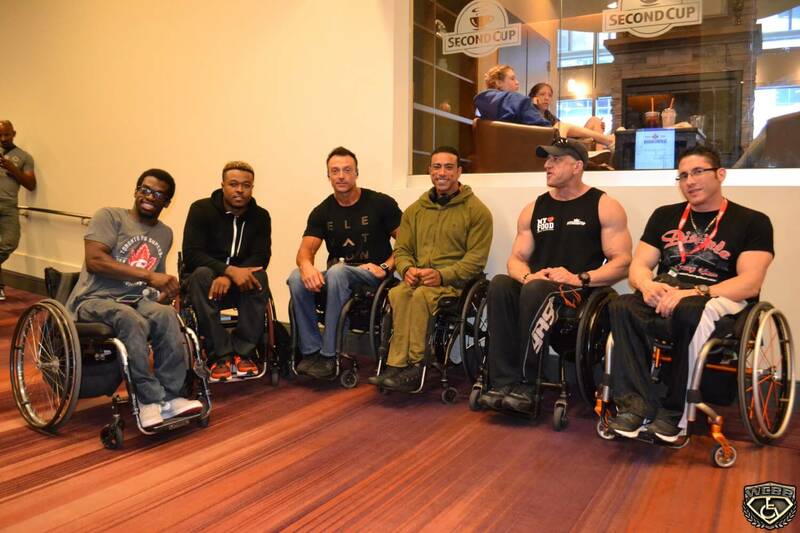 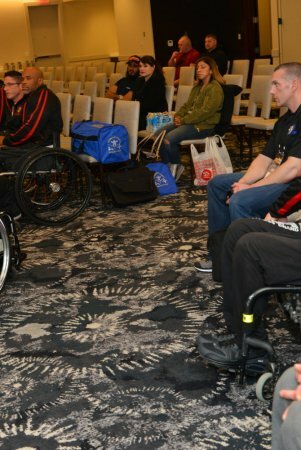 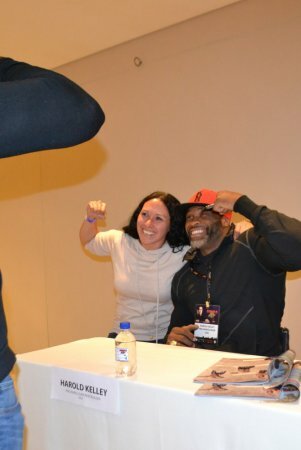 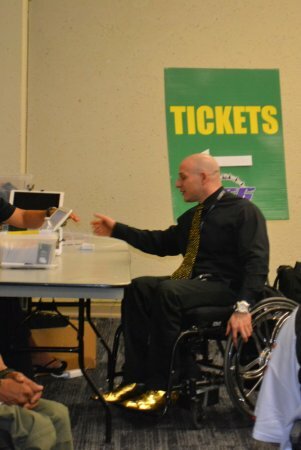 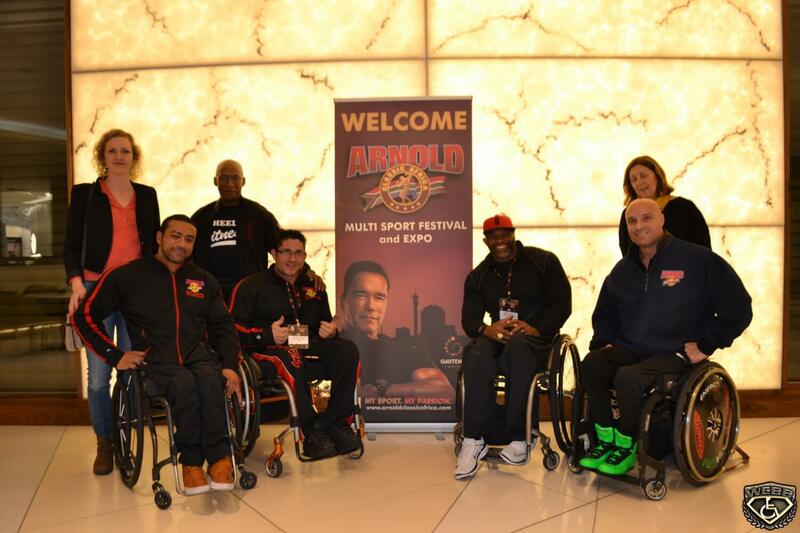 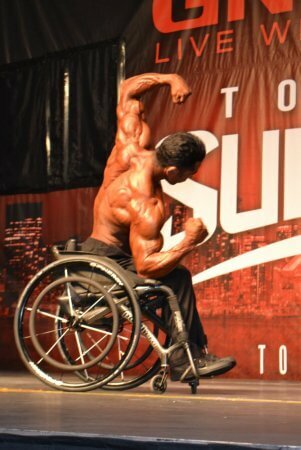 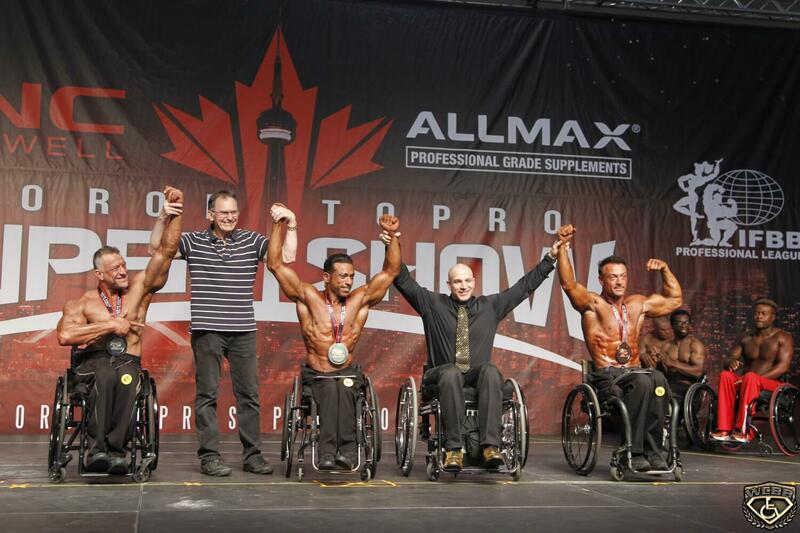 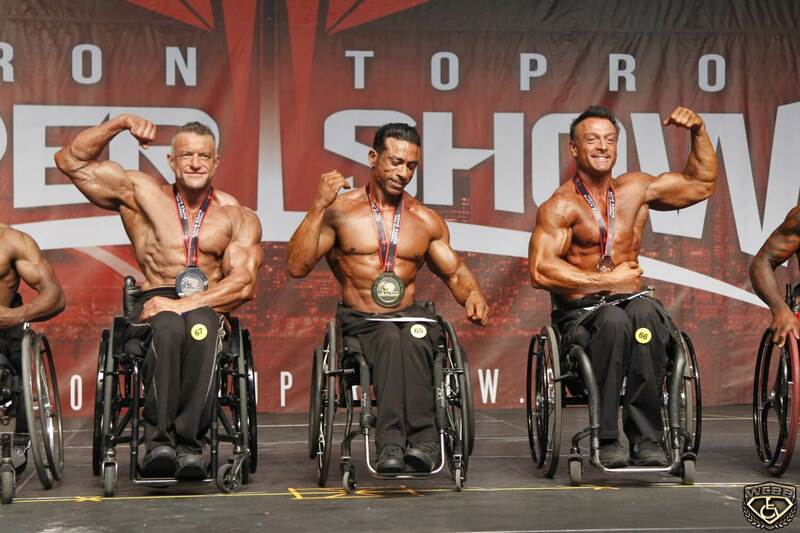 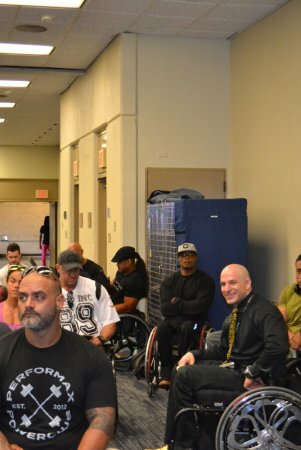 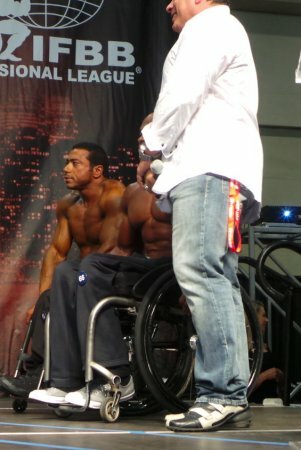 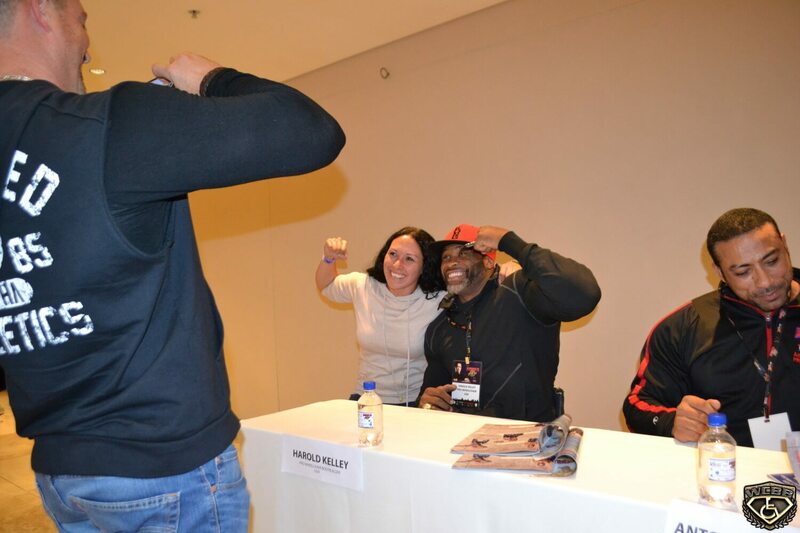 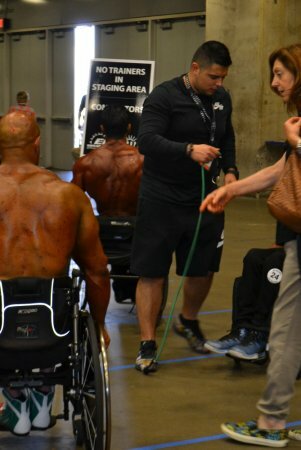 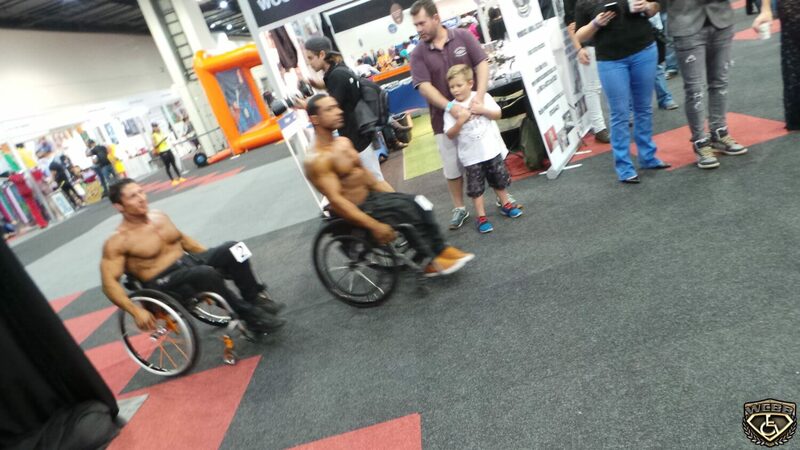 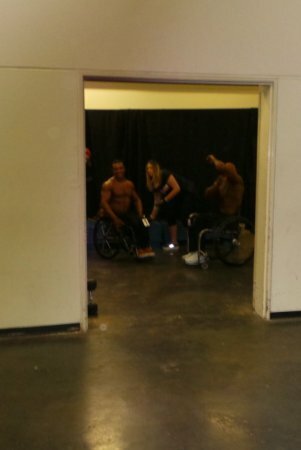 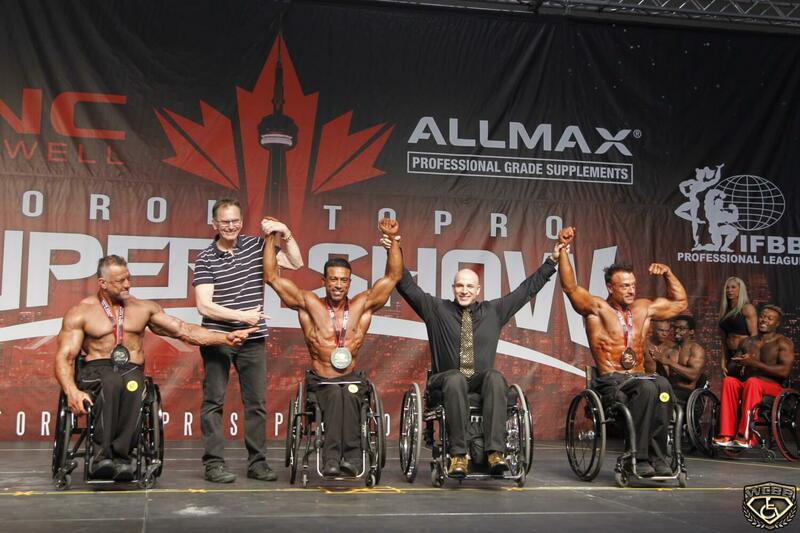 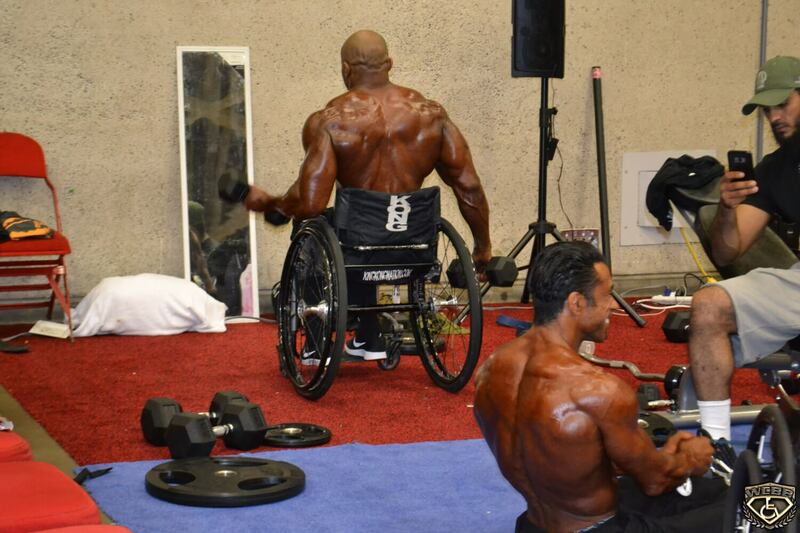 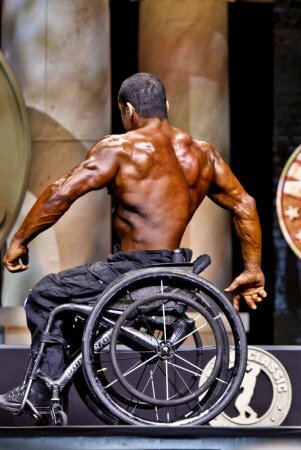 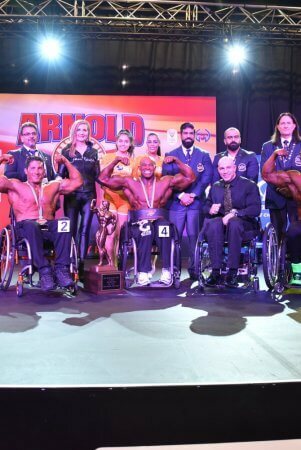 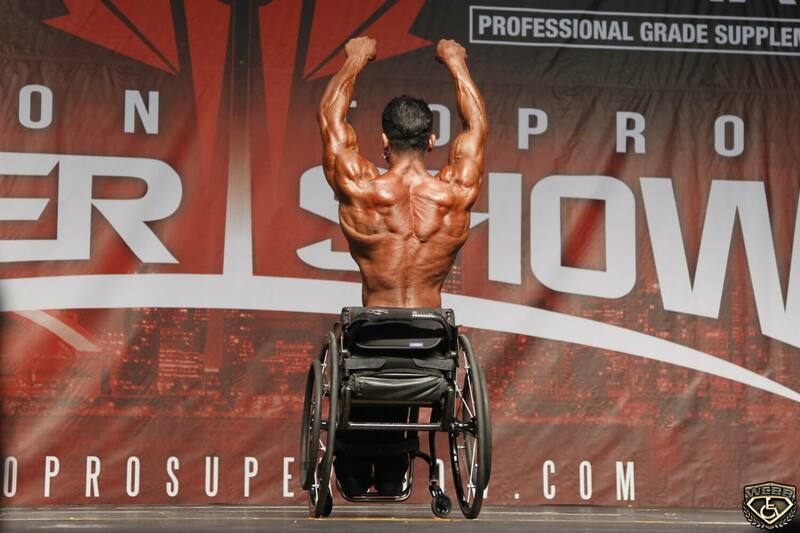 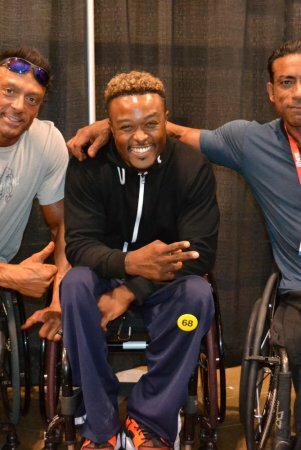 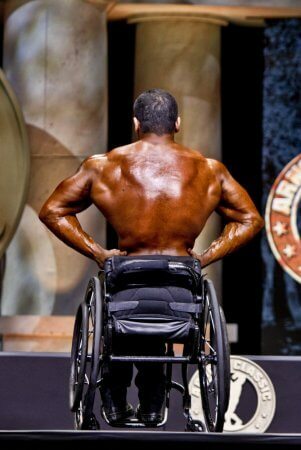 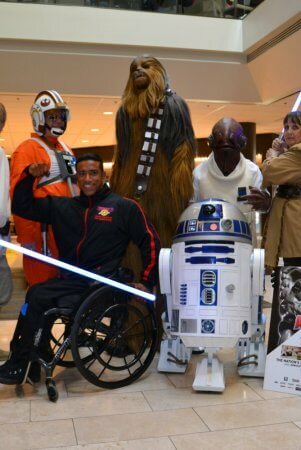 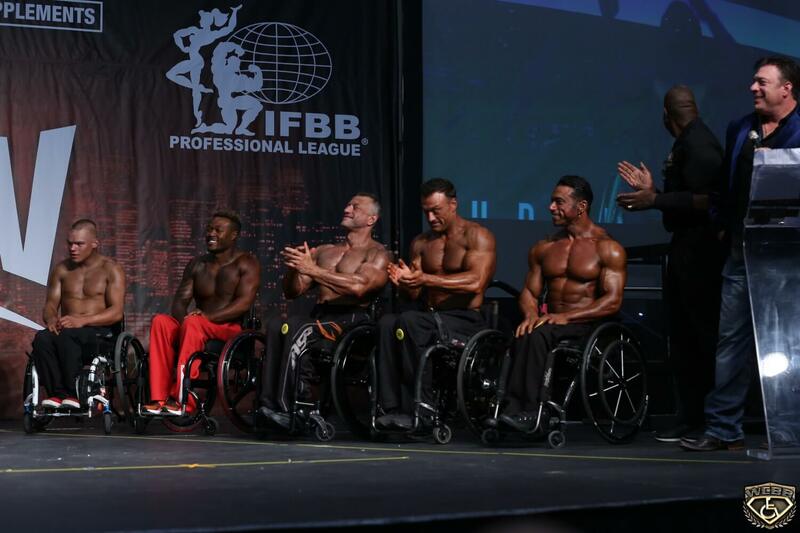 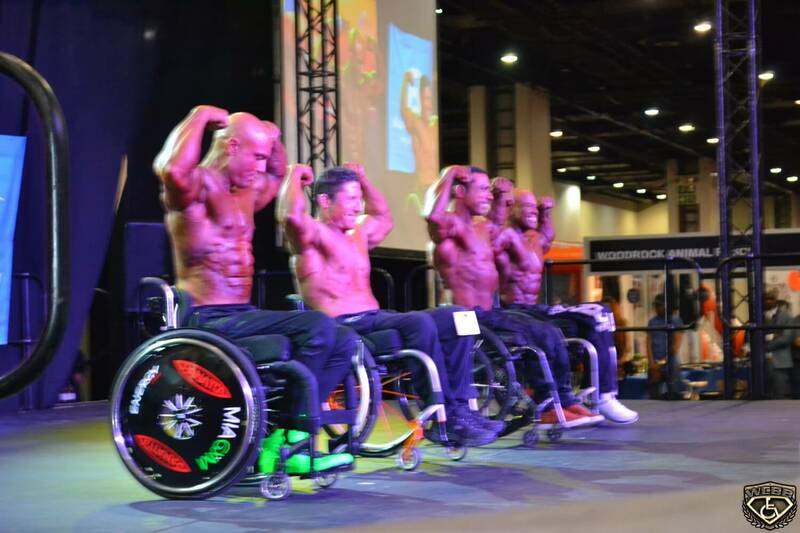 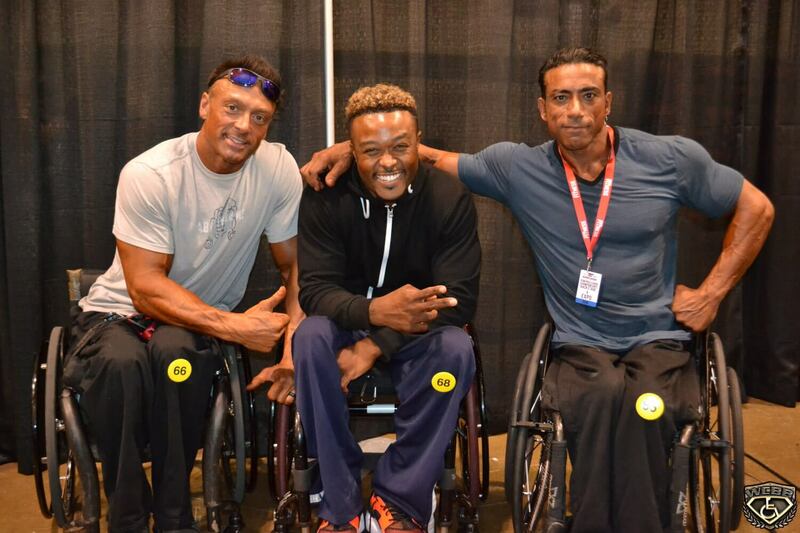 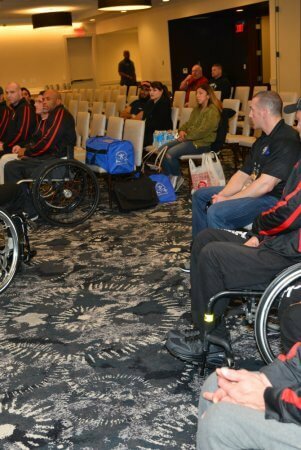 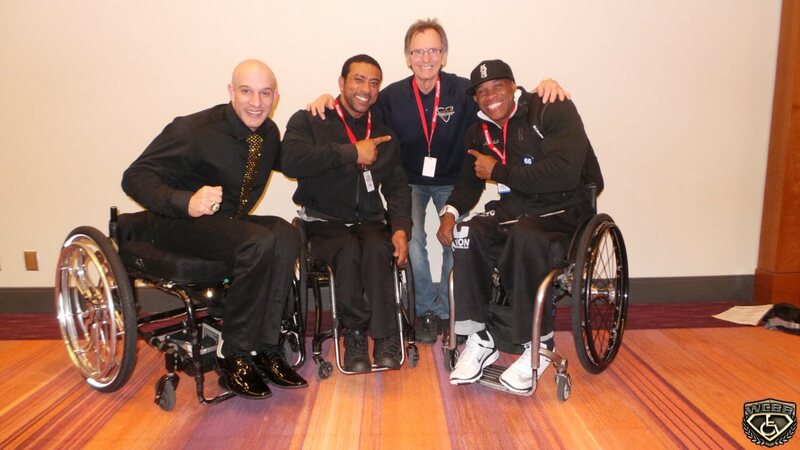 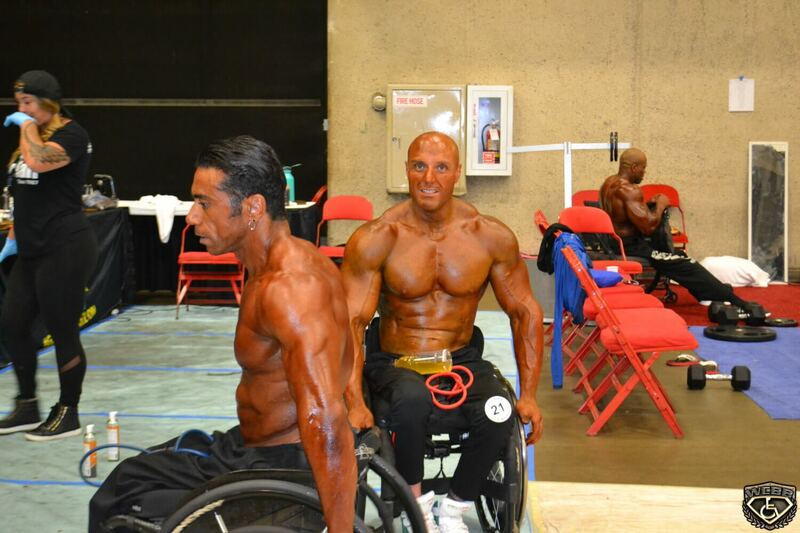 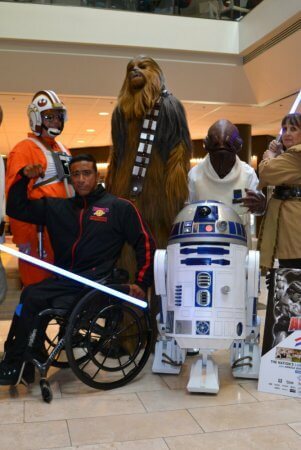 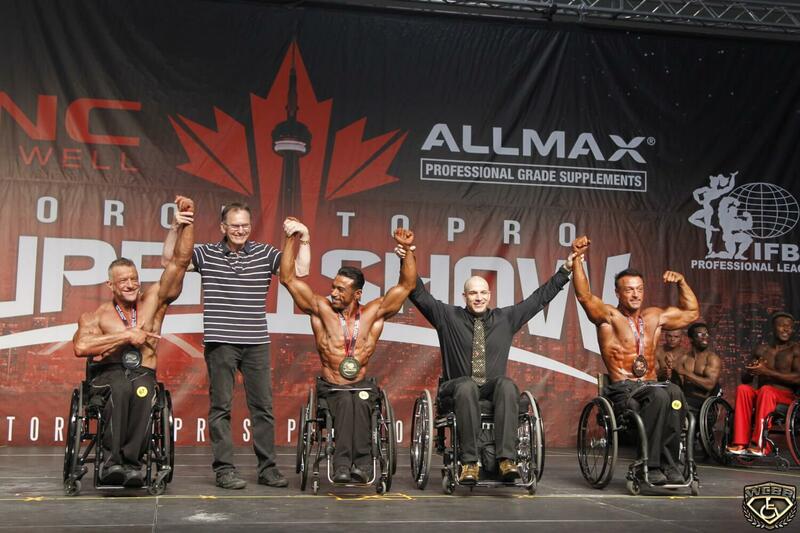 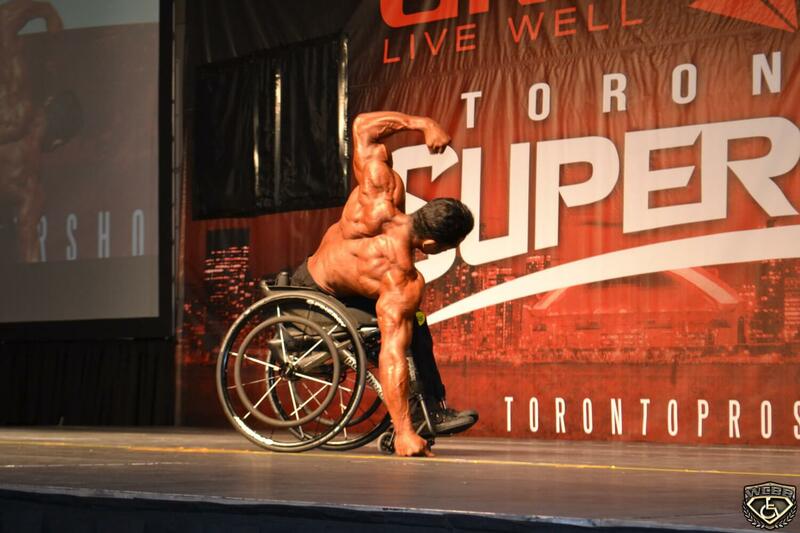 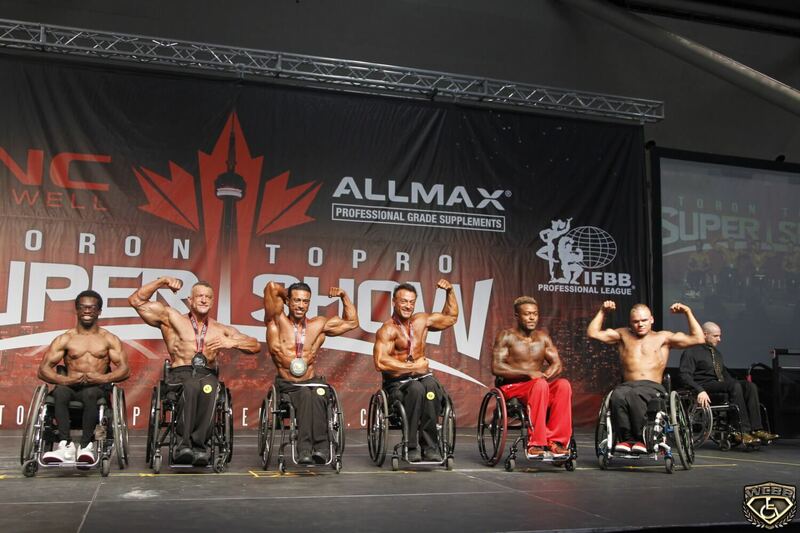 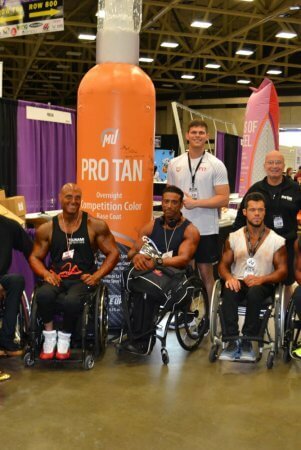 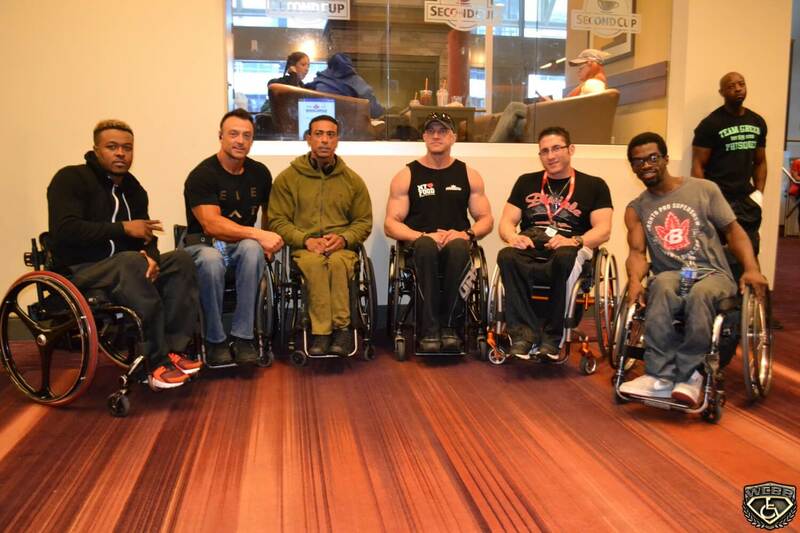 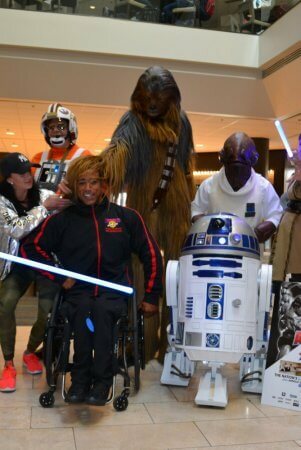 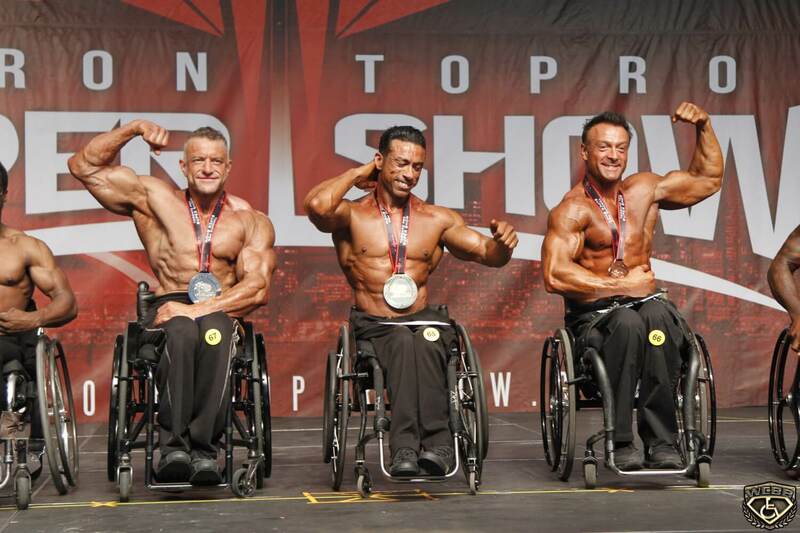 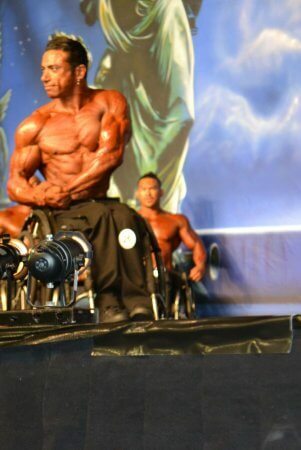 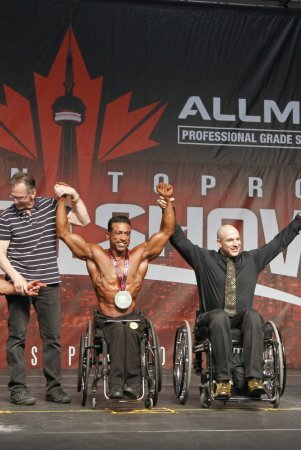 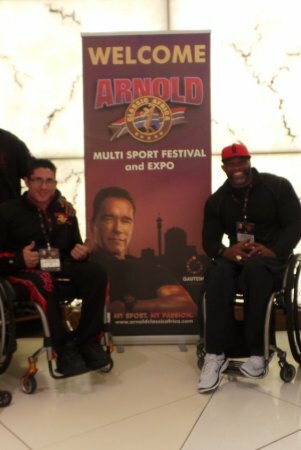 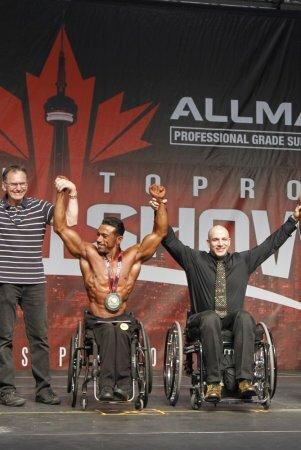 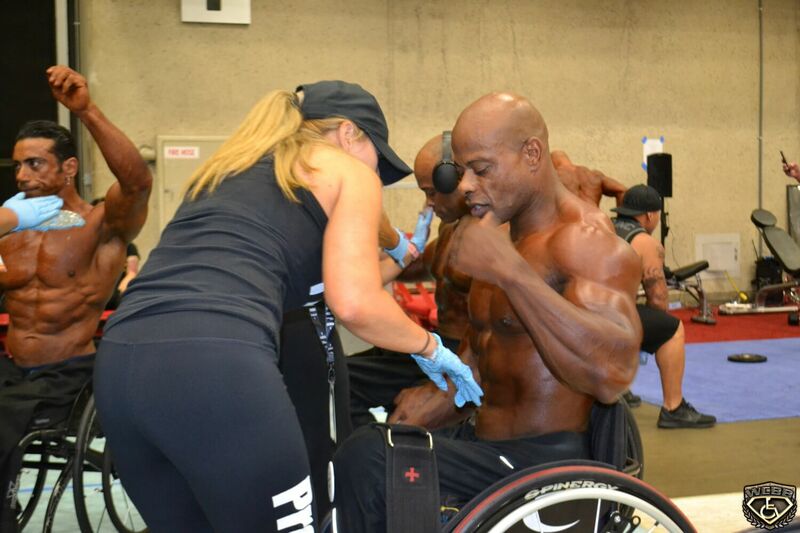 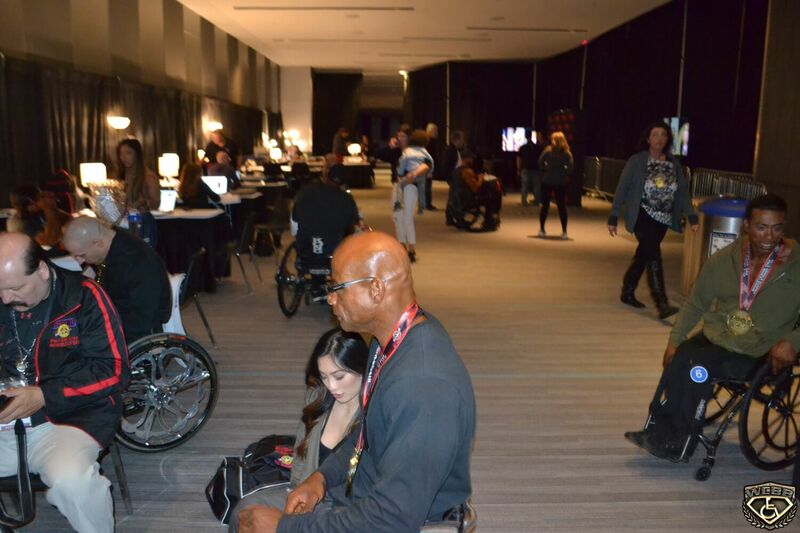 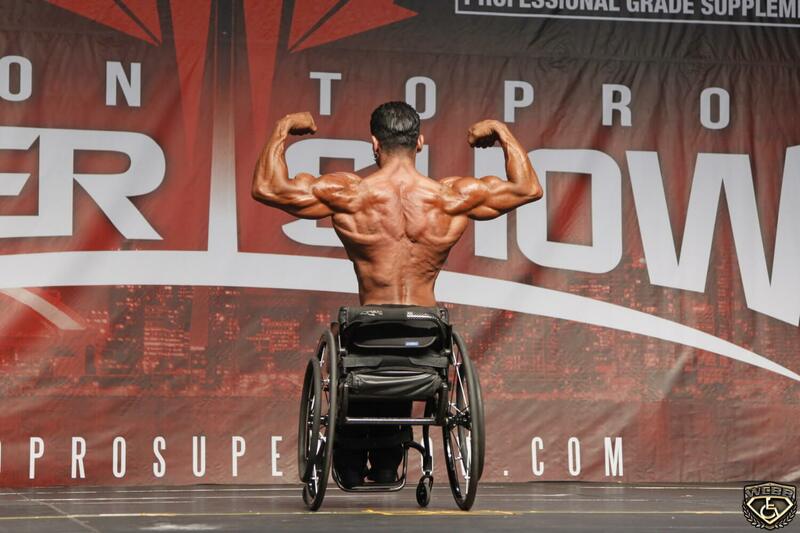 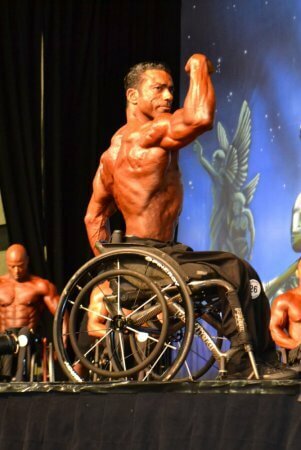 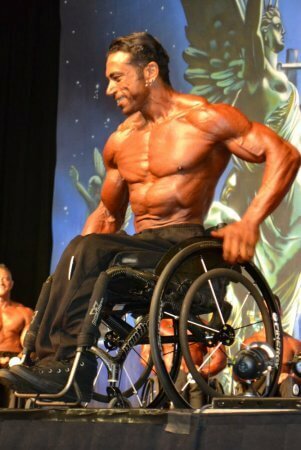 This made me the first wheelchair bodybuilder from Sweden and I have been competing ever since. 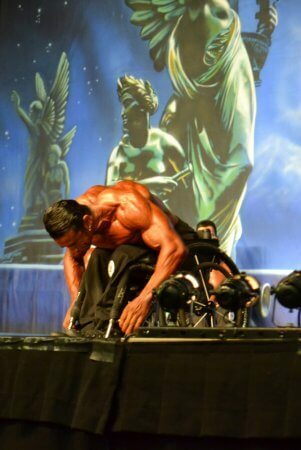 I became a bodybuilder due to my desire to fulfill a dream. 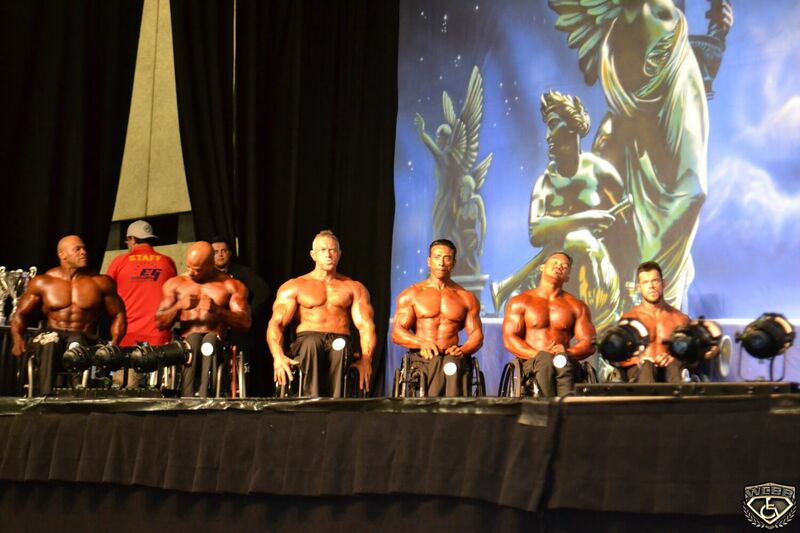 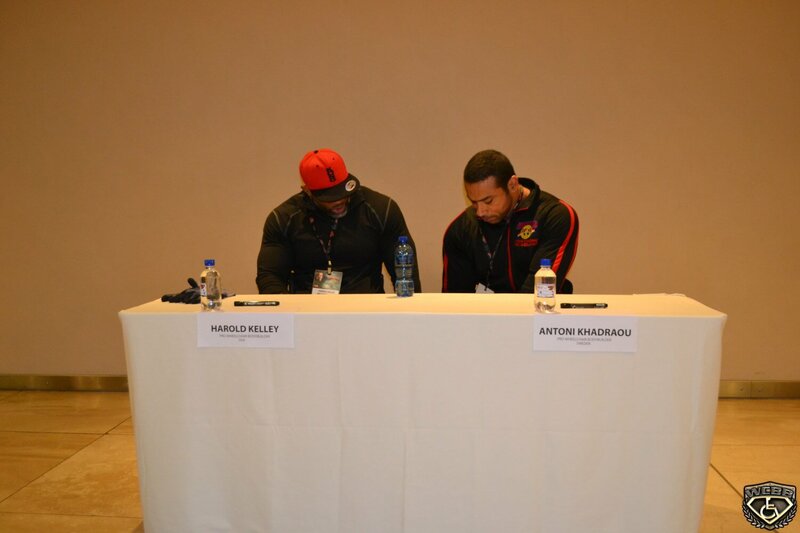 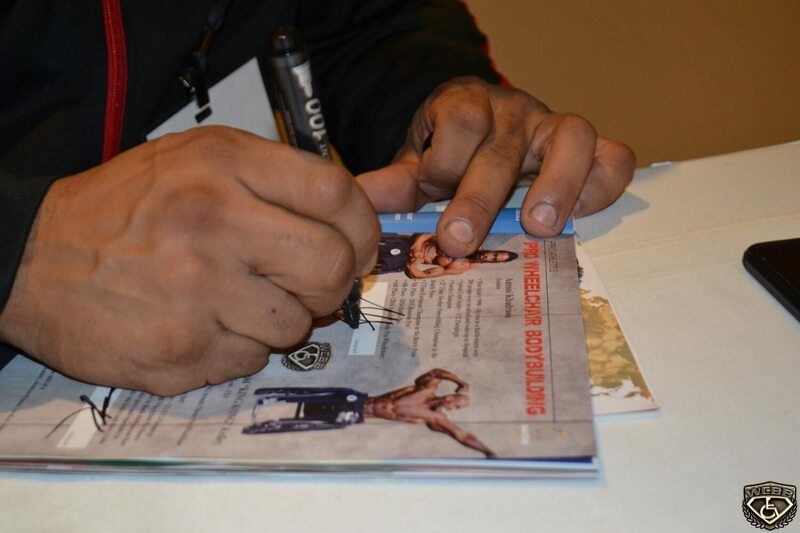 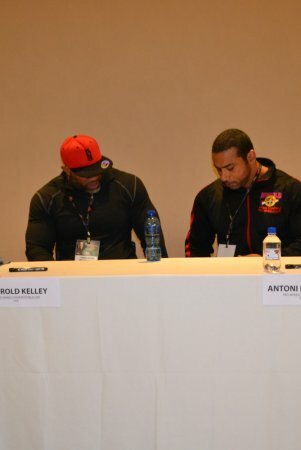 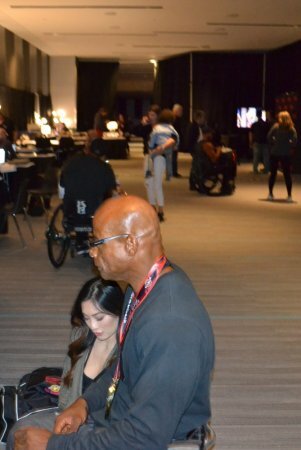 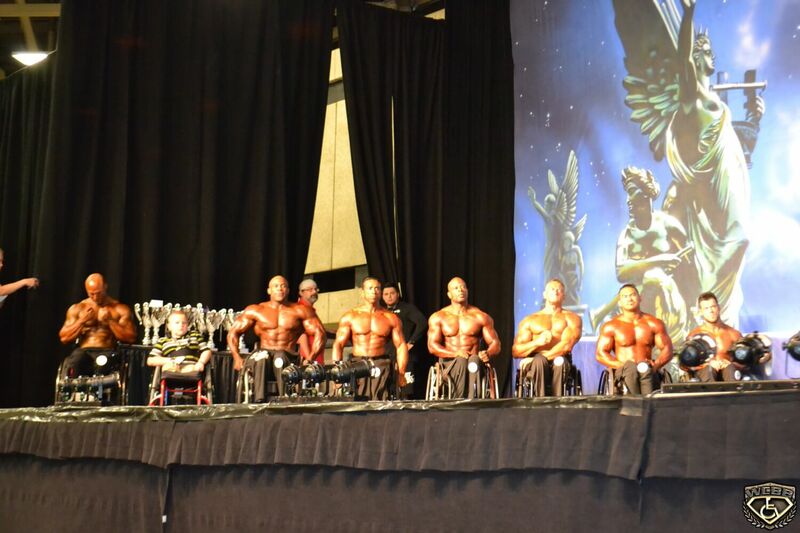 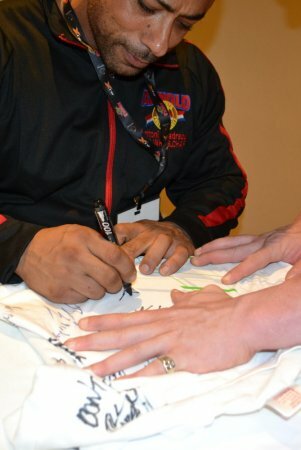 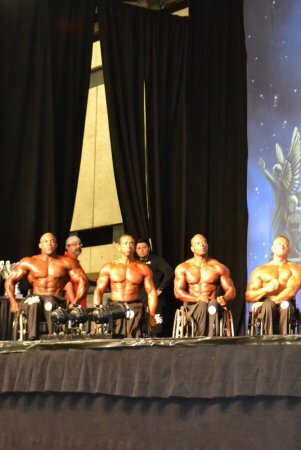 At the age of 16, I had dreamed of being in the Olympia and obtaining the title of Mr. Olympia. 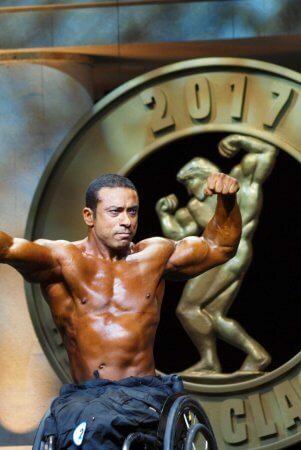 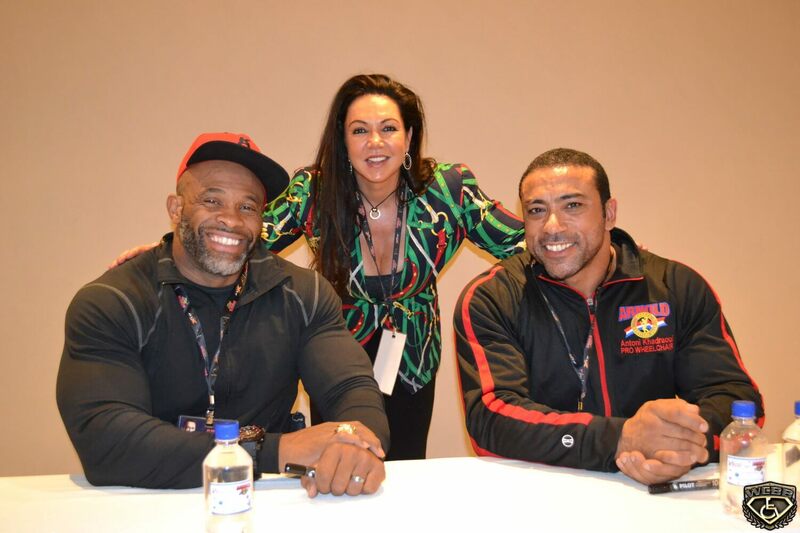 As Europe did not of the Olympia's I began bodybuilding and bodybuilding which led to being able to compete and winning many competitions. 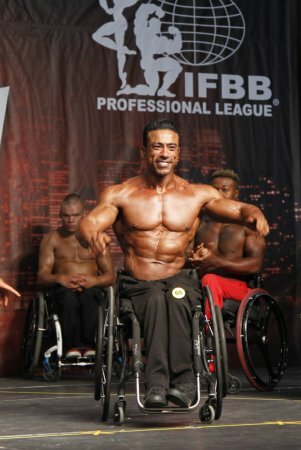 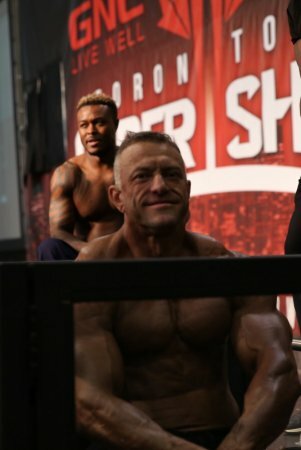 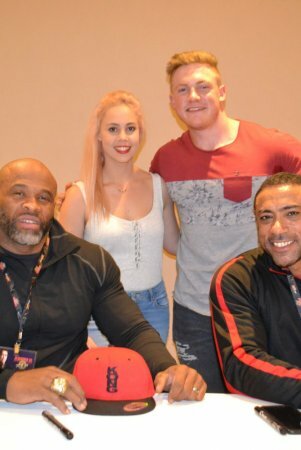 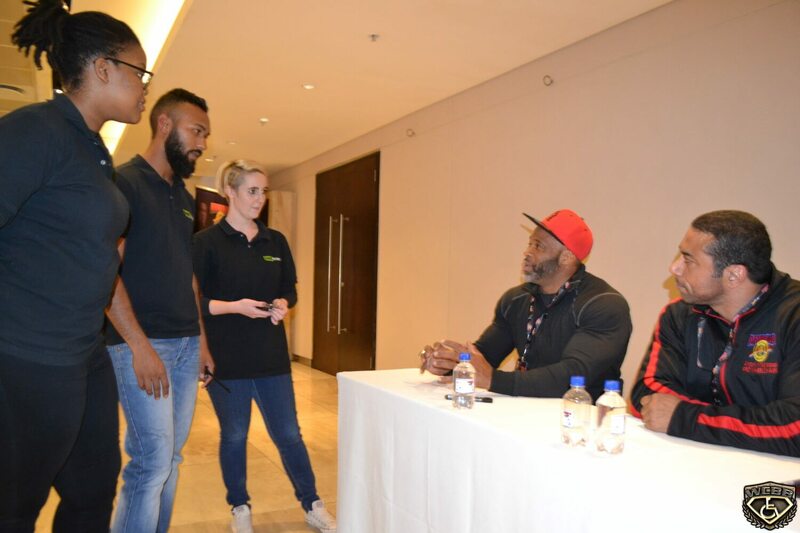 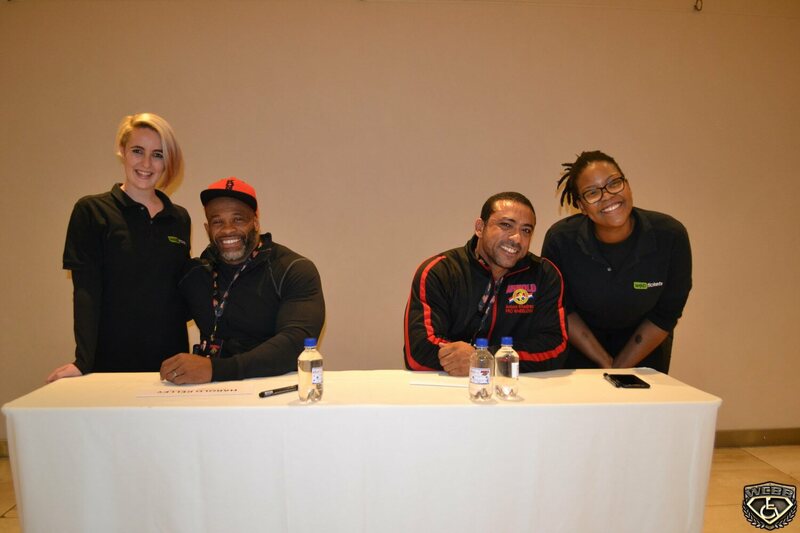 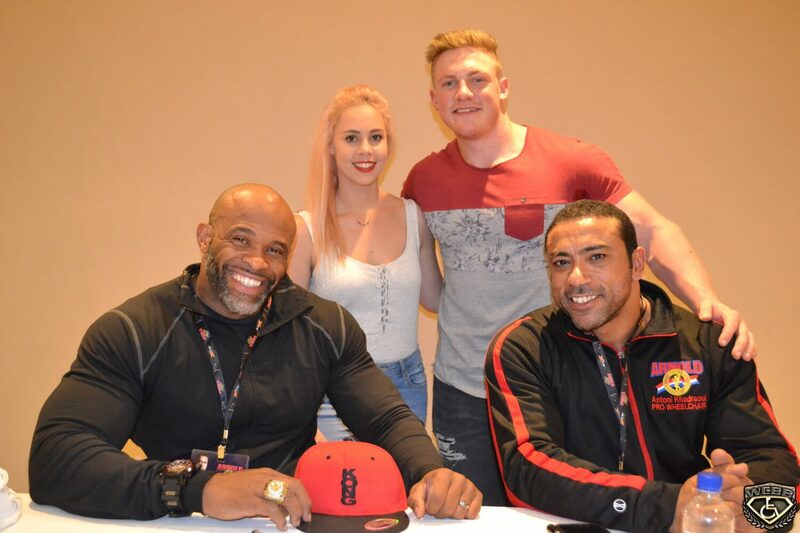 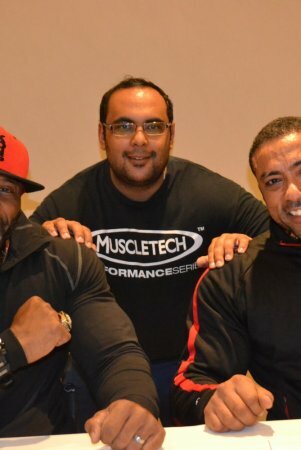 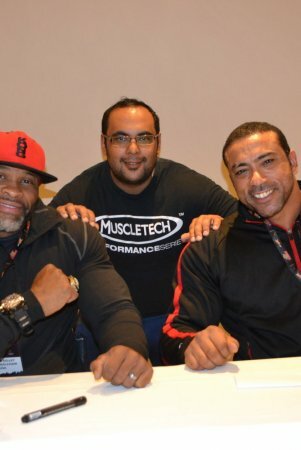 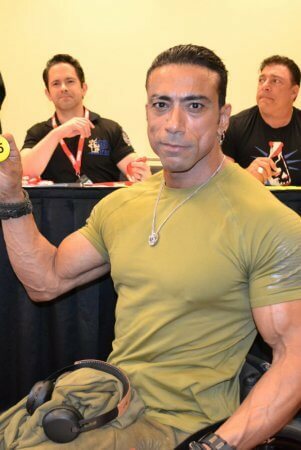 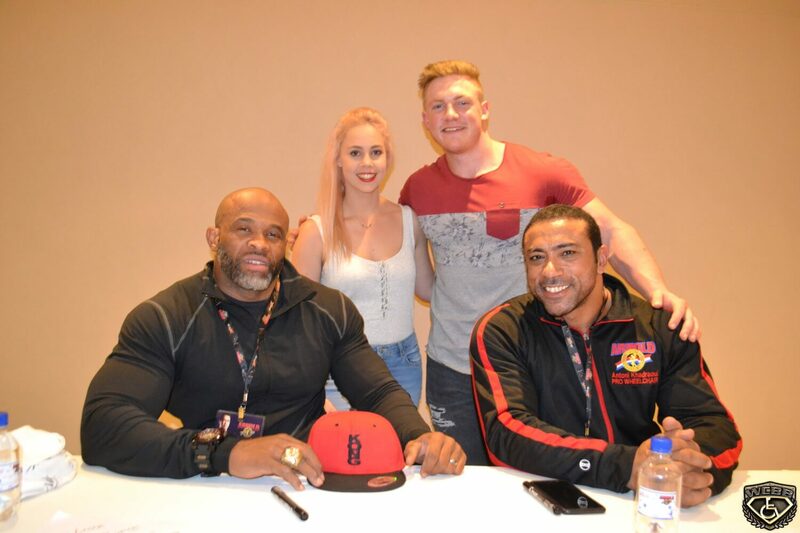 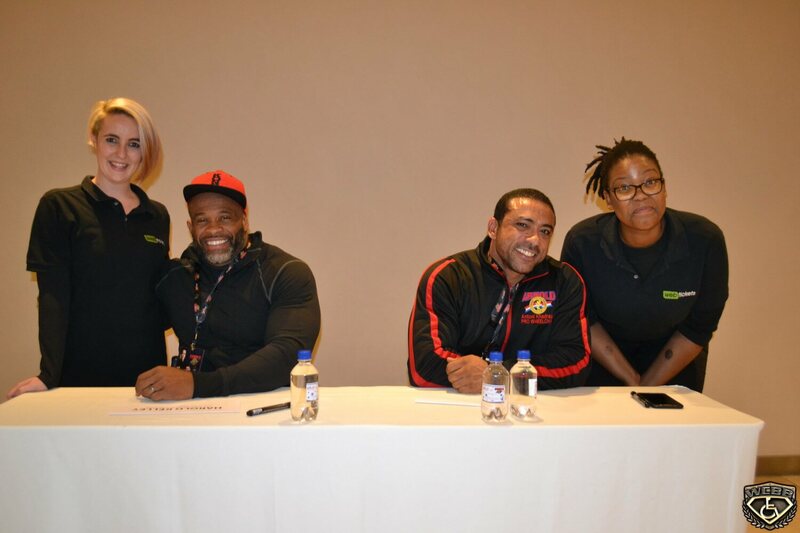 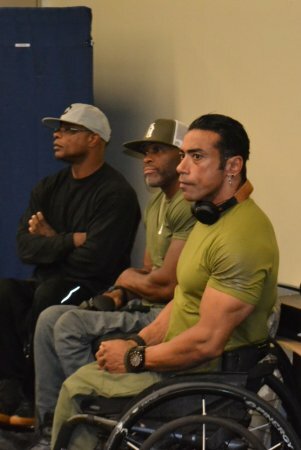 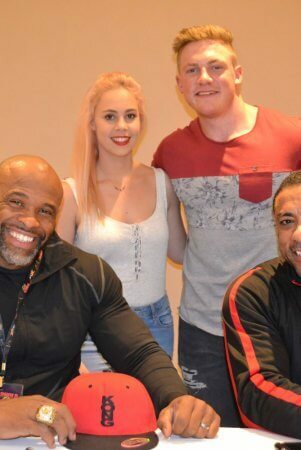 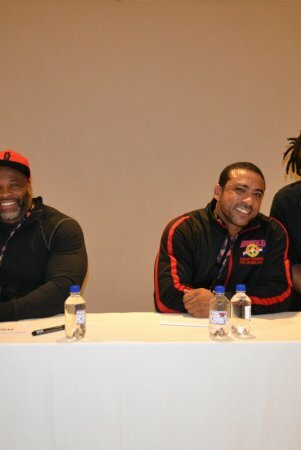 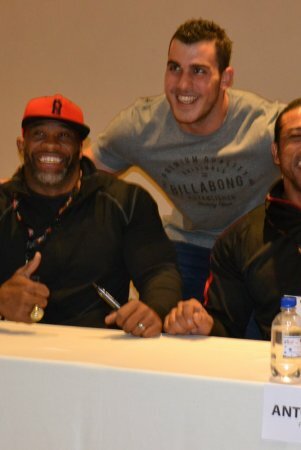 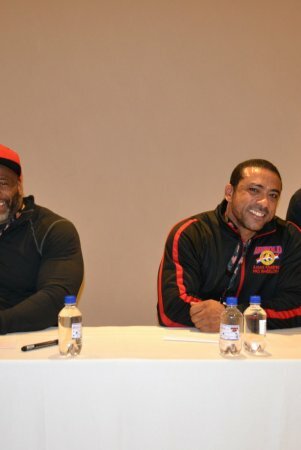 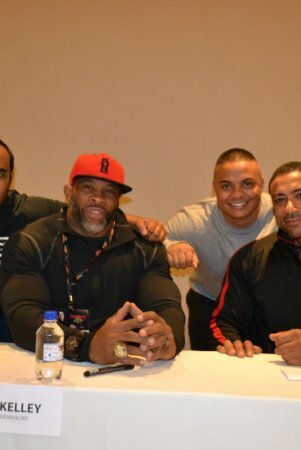 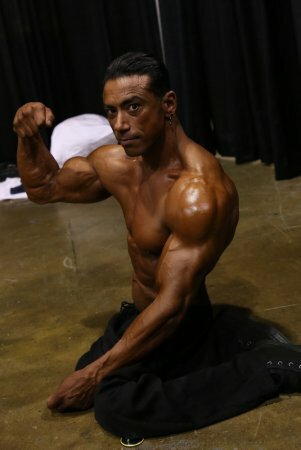 I started my bodybuilder career by bench pressing and working on my biceps and upper body strength which rewarded me with winning several competitions. 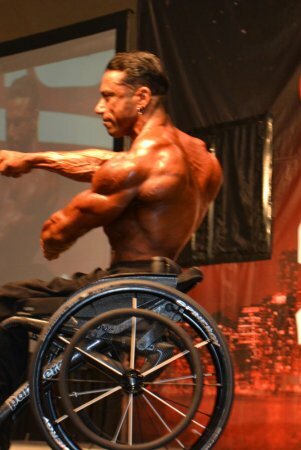 I later began bodybuilding and focusing on strictly on that. 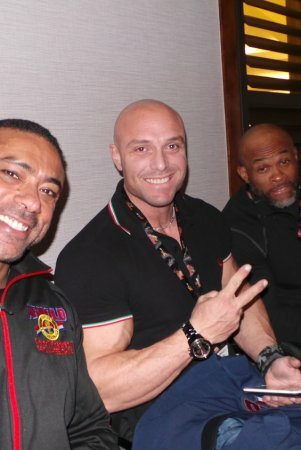 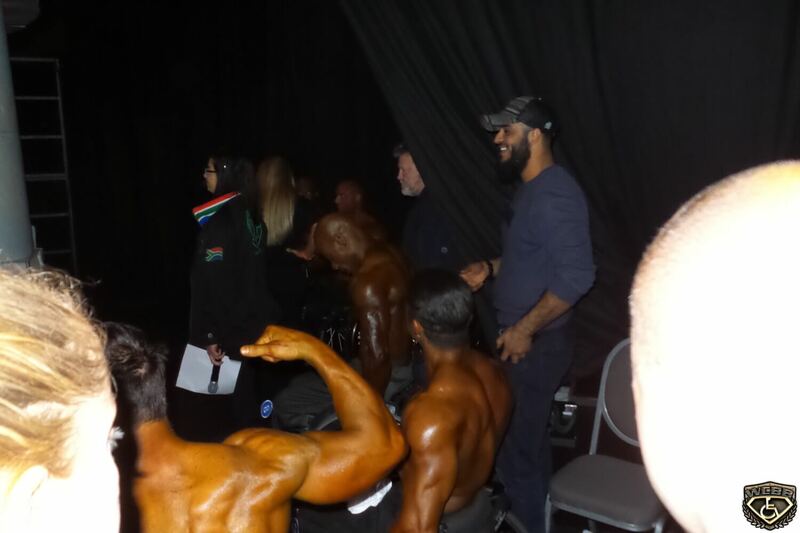 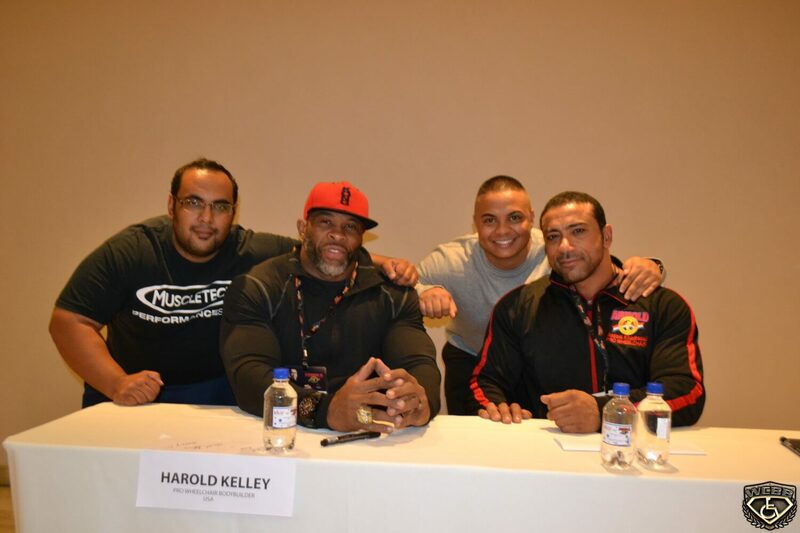 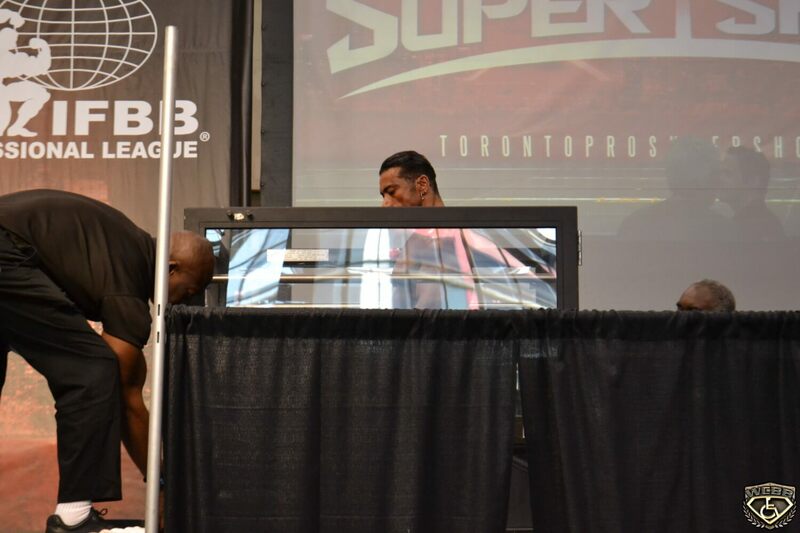 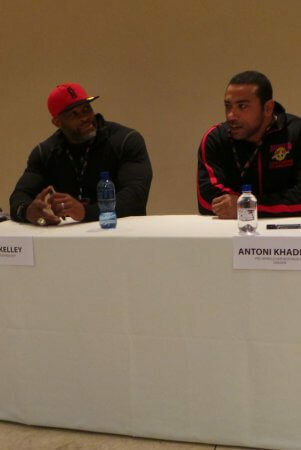 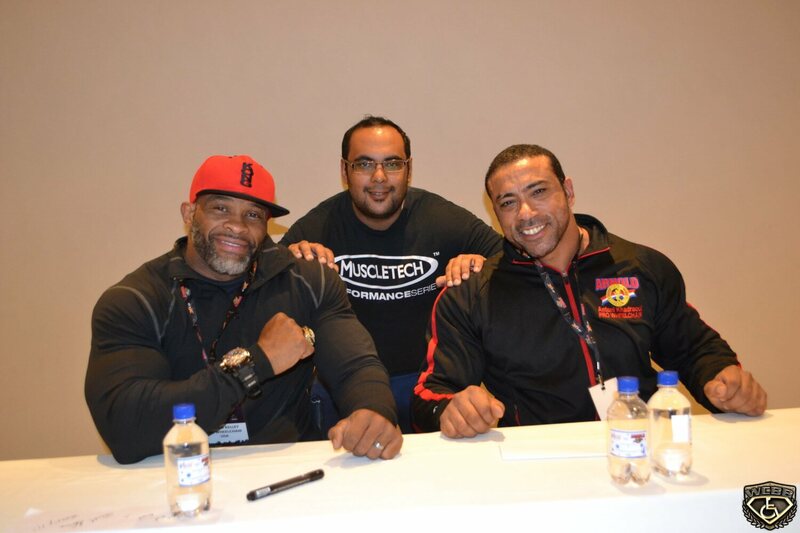 Soon it was all about the bodybuilding lifestyle for me and about competing. I am totally motivated by people telling me that I cannot do certain tasks. 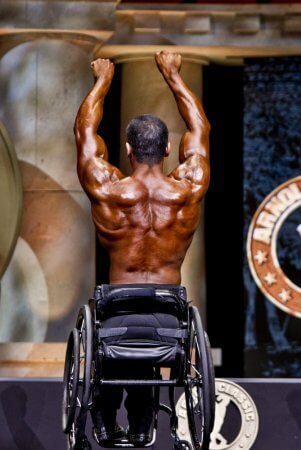 It motivates me to be able to prove them wrong. 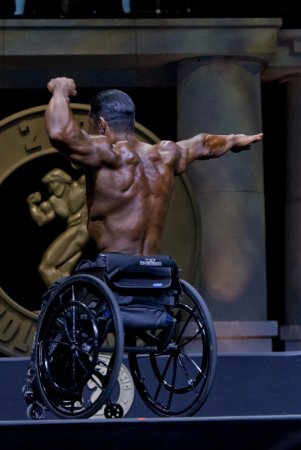 I don't believe that any doors are closed to me and proving that all doors are opened for me is my main drive. 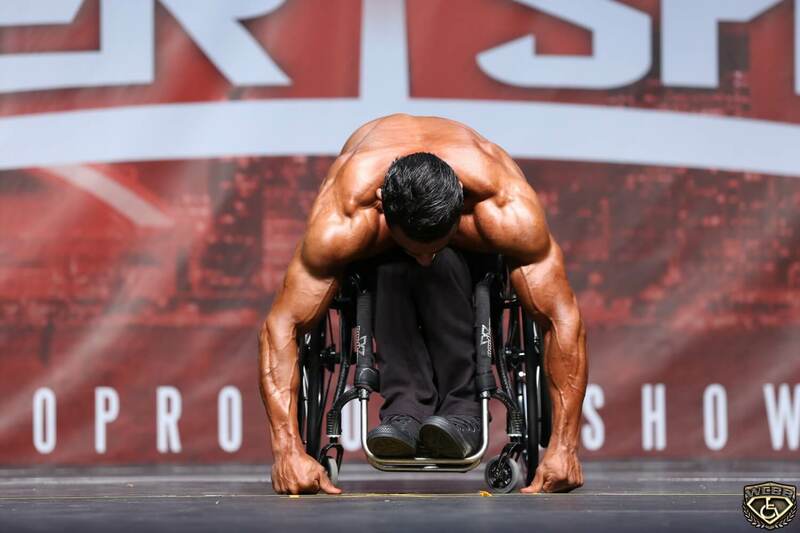 Setting and reaching my own goals helps to drive me harder and accomplish the task that I have at hand. 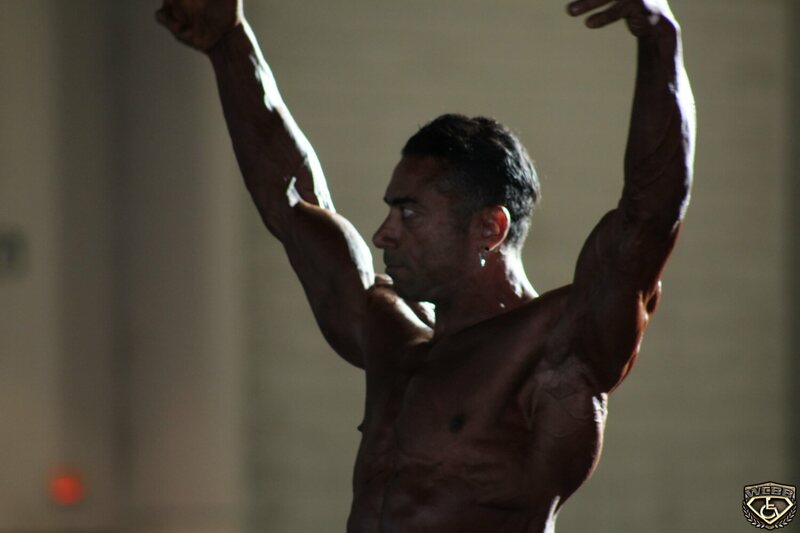 Meeting the goals that I set for myself encourages me to set higher goals and standards to strive for. 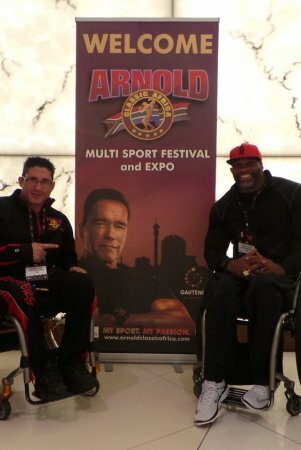 My suggestions and tips for others to obtain their goals are to focus strictly on yourself. 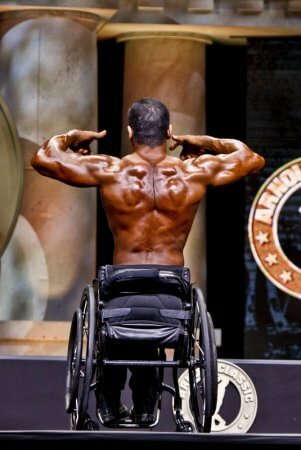 Don't ever try to be stronger than you are as this can lead to injury as well as disappointment. Don't try to compare yourself to others and don't push yourself to be stronger than those that you are competing with. 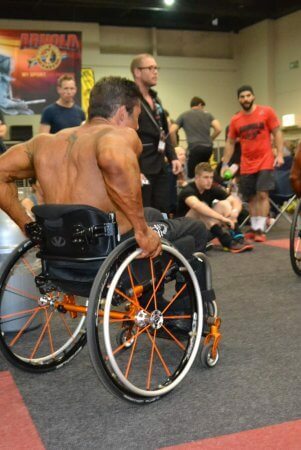 Don't train for others, train only for yourself. 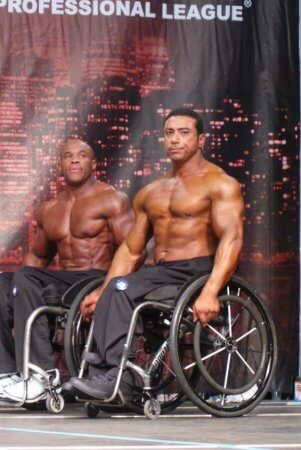 Strive to be beautiful for you both physically, and mentally. 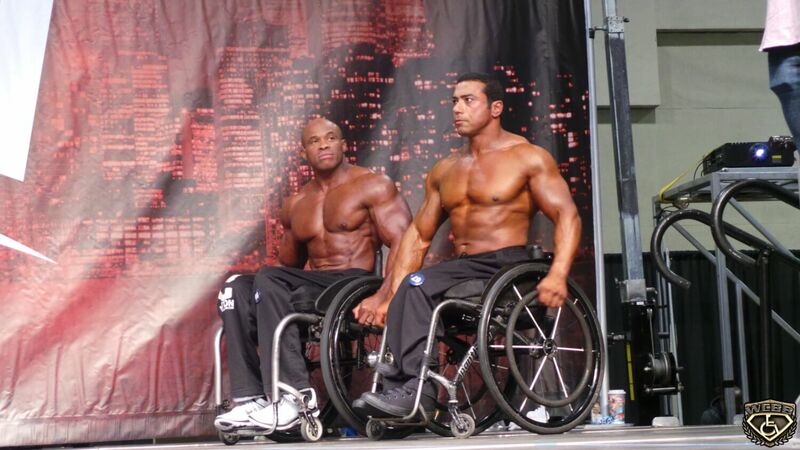 Don't be a show off and always be aware of your own strengths and limitations. 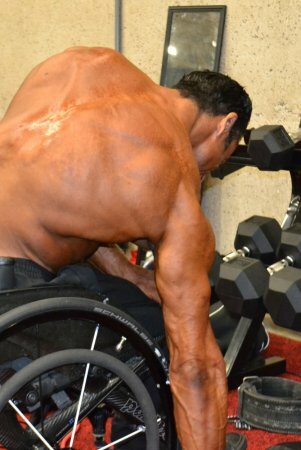 Know your weaknesses as well and work to strengthen them.